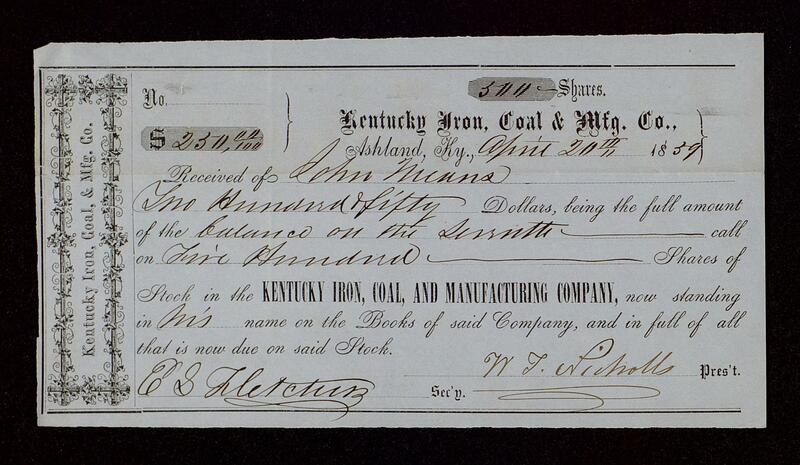 The Means family played a dominant role in the development of the iron industry in the Hanging Fork region of southern Ohio and in eastern Kentucky. 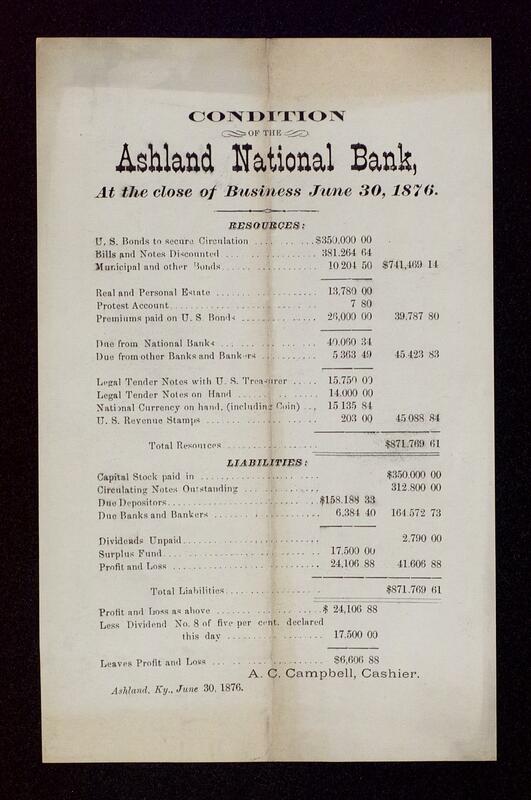 They also played a prominent part in the development of both river and rail transportation in the area and in the formation of Ashland, Kentucky as an industrial city. 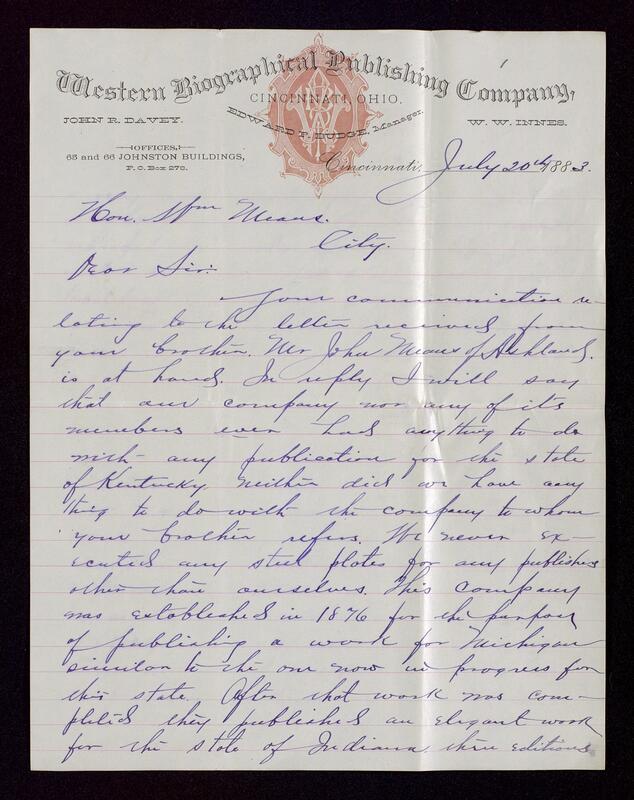 These papers include both personal and business-related correspondence, financial records, legal documents, memorabilia, newspaper clippings, journals, scrapbooks, and photographs. 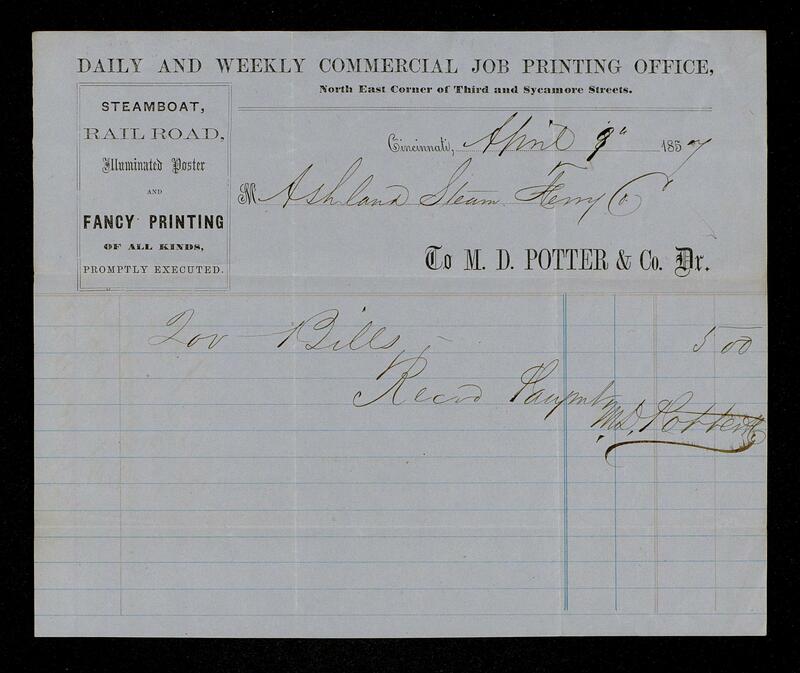 River steamers -- United States. 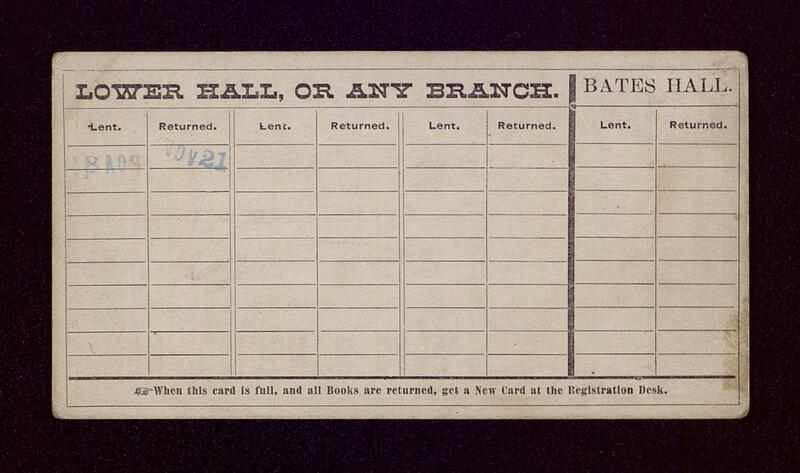 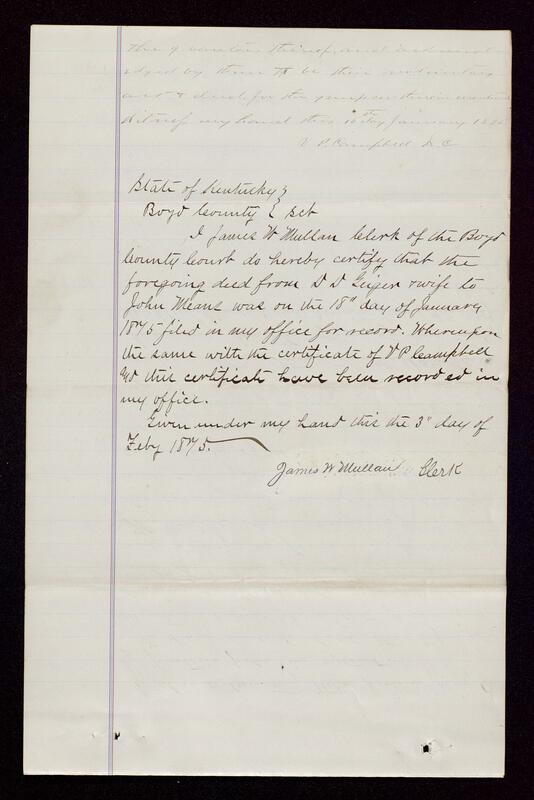 Banks and banking -- Kentucky. 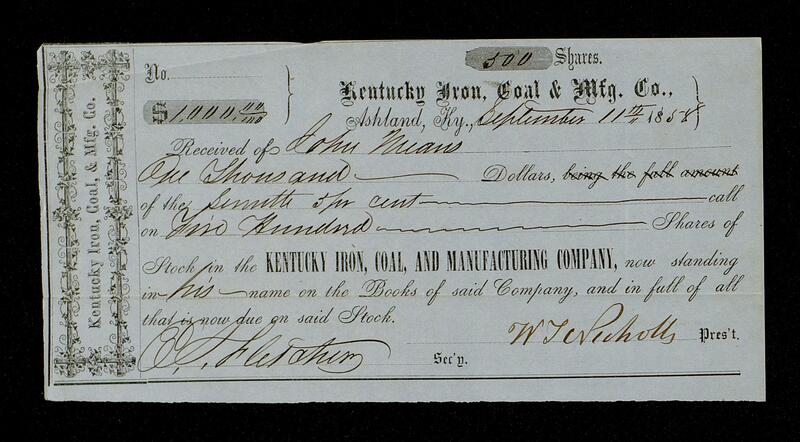 Iron industry and trade -- Kentucky. 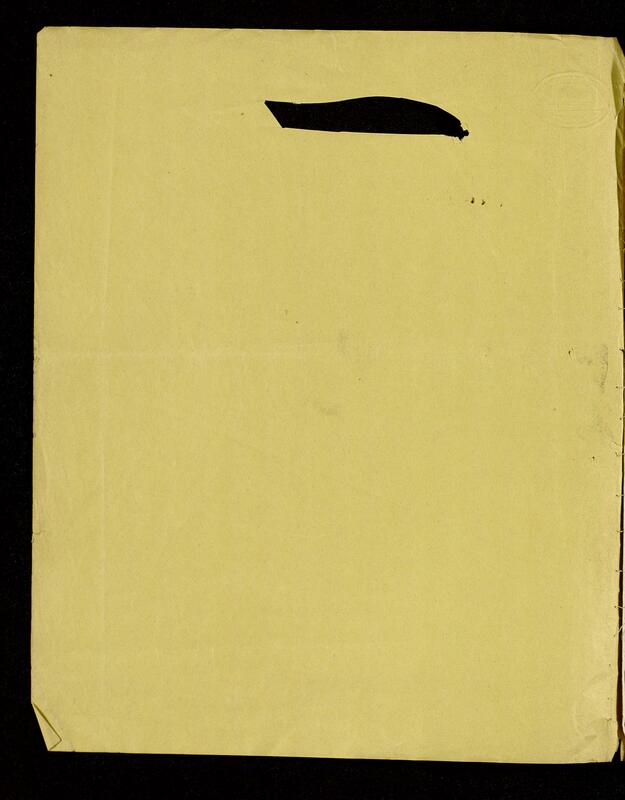 Organized by type of material; arranged chronologically thereunder. 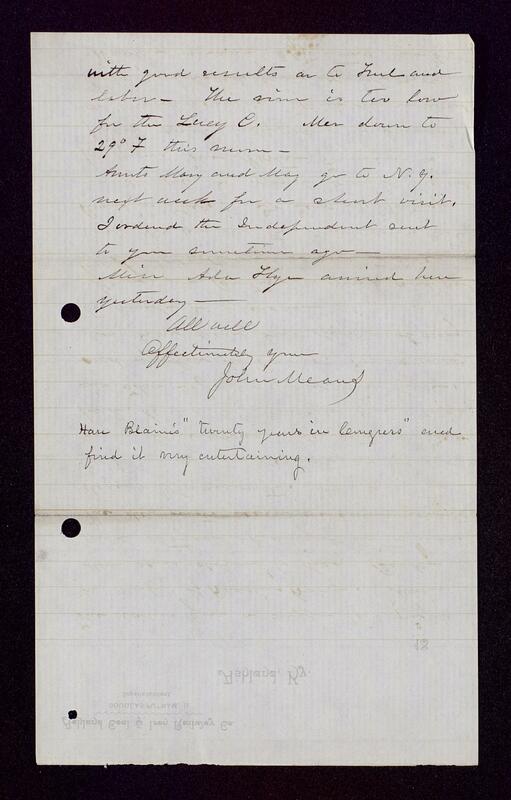 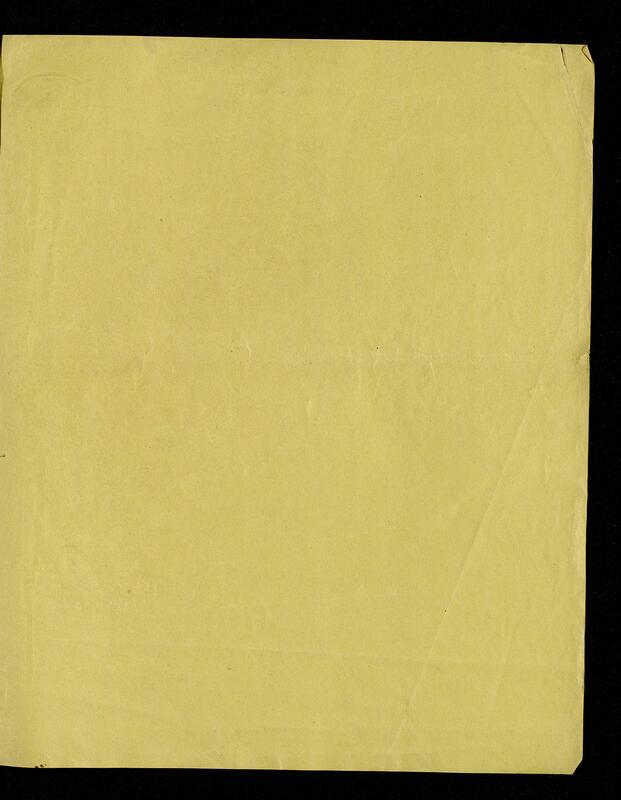 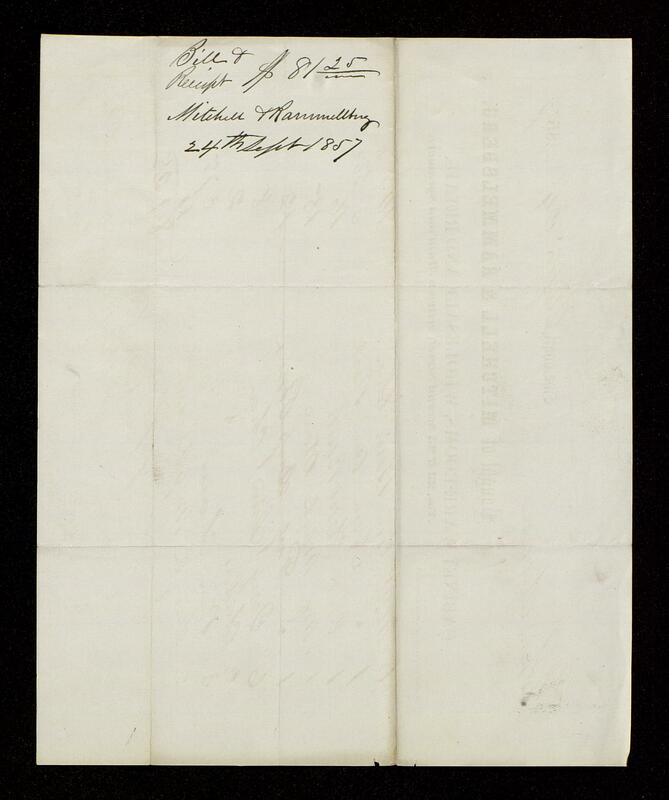 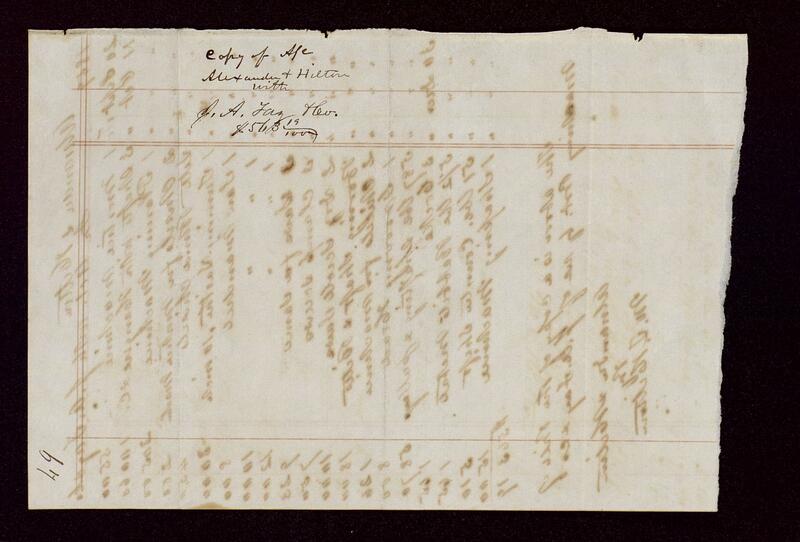 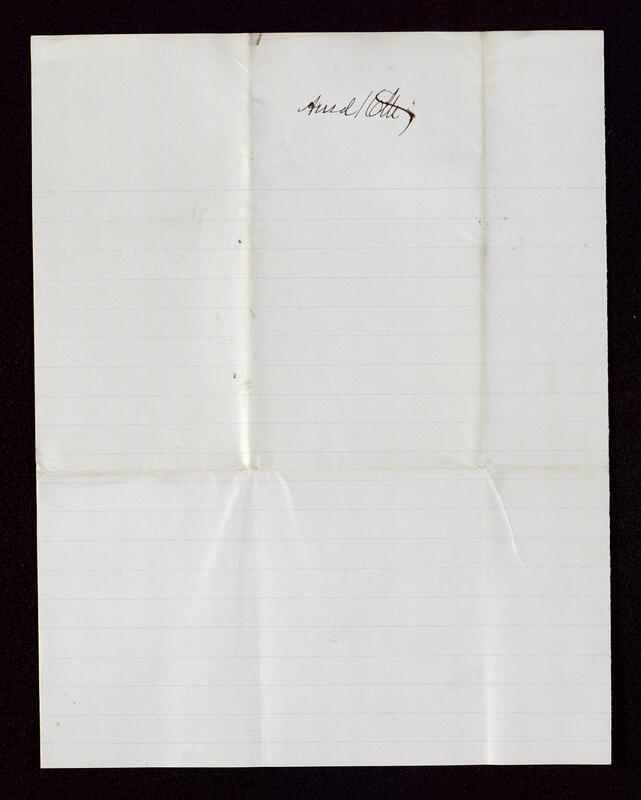 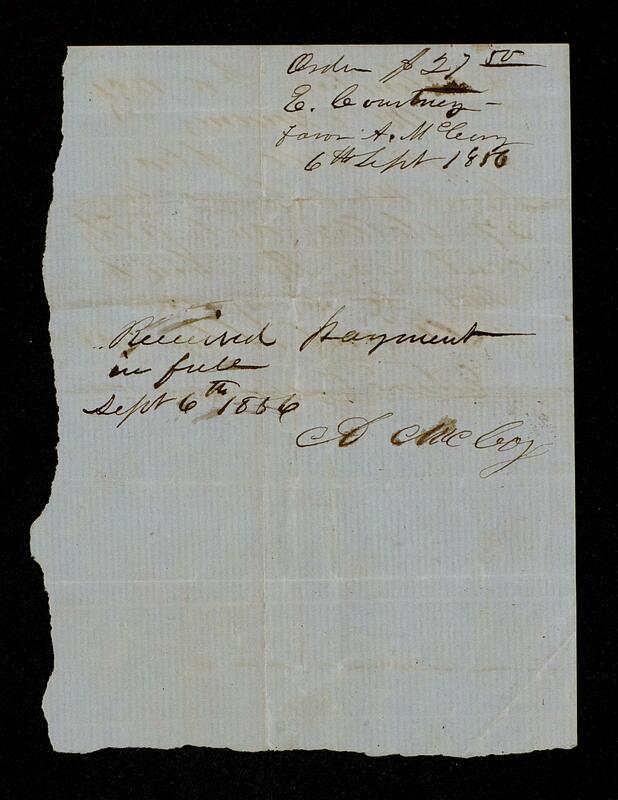 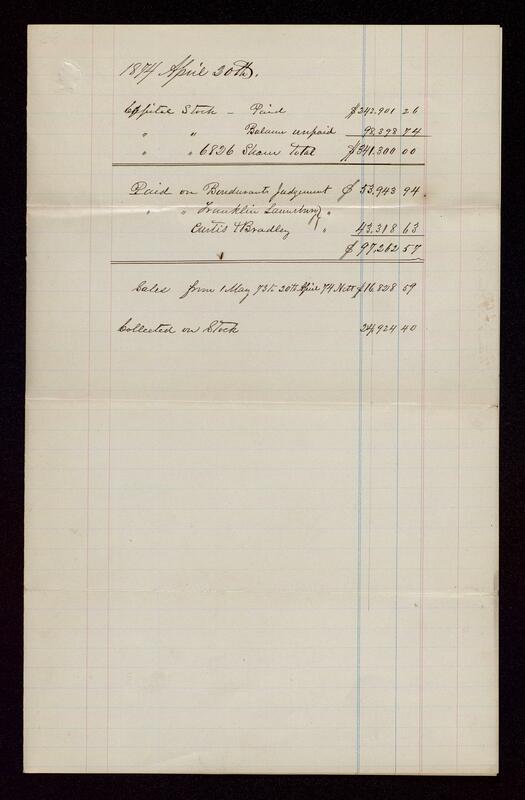 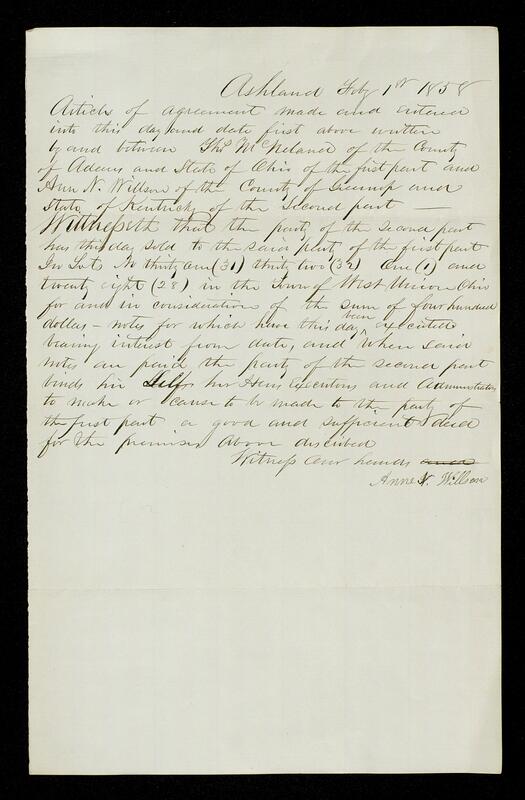 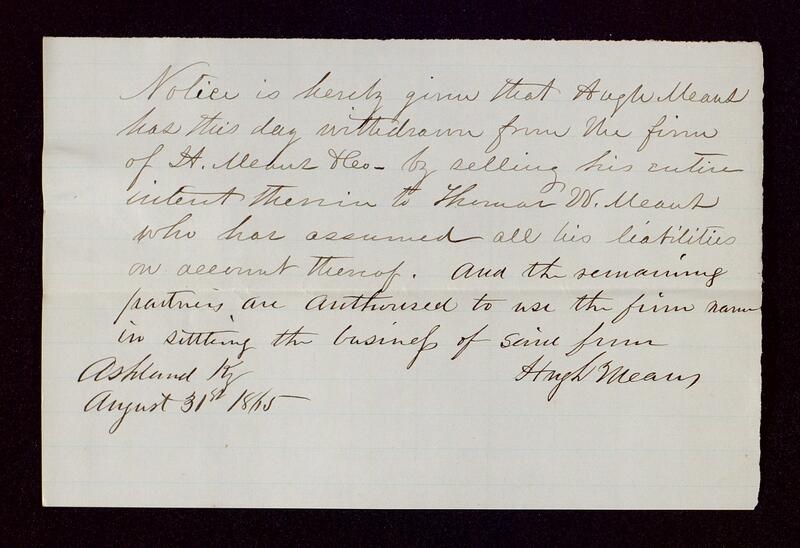 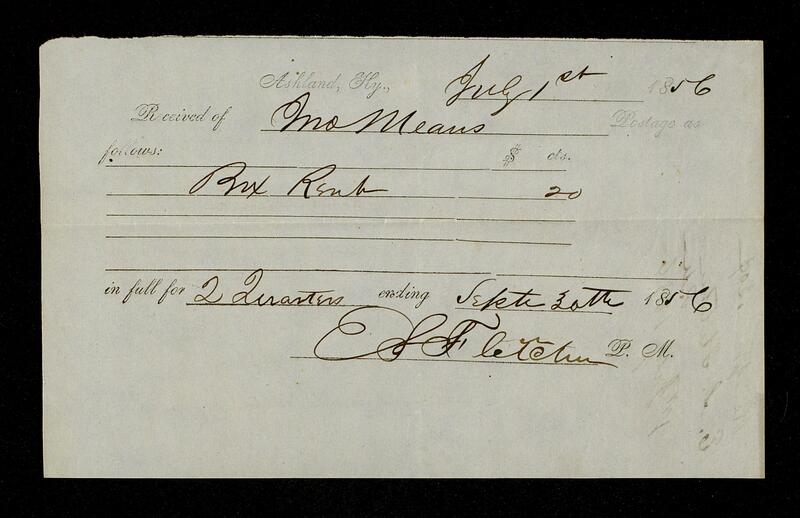 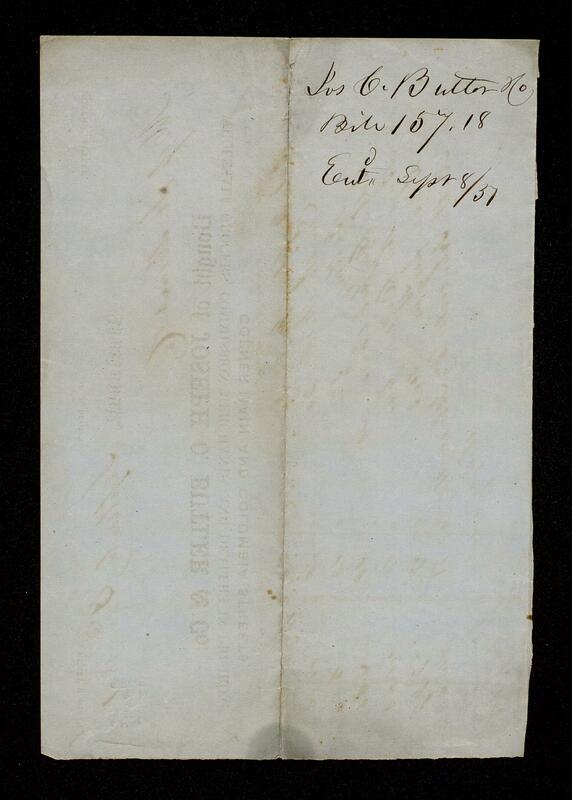 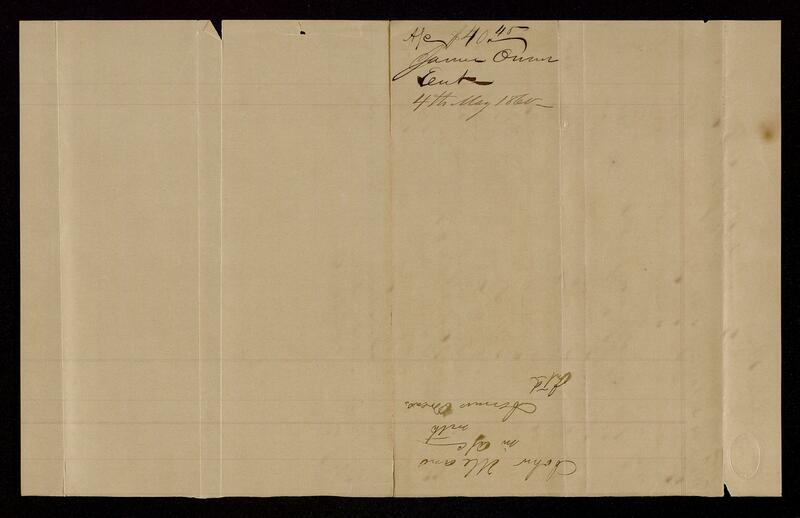 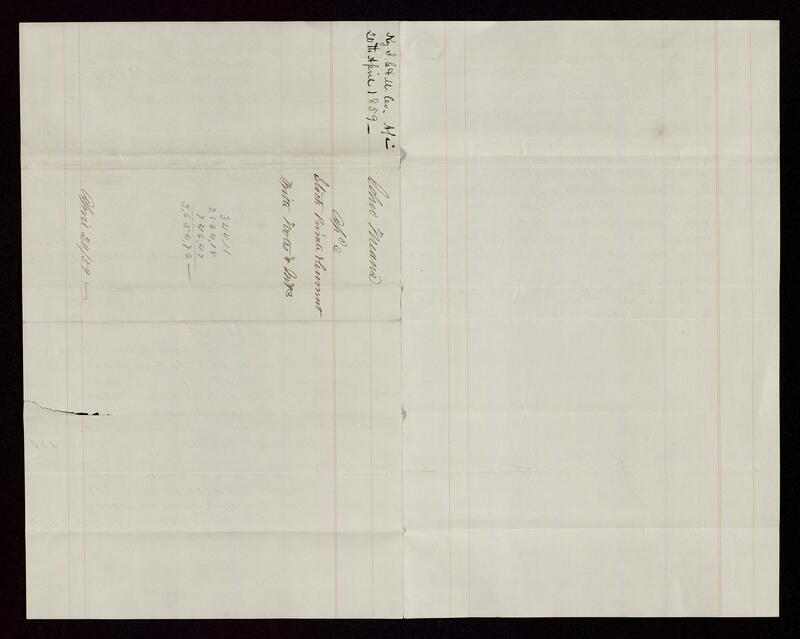 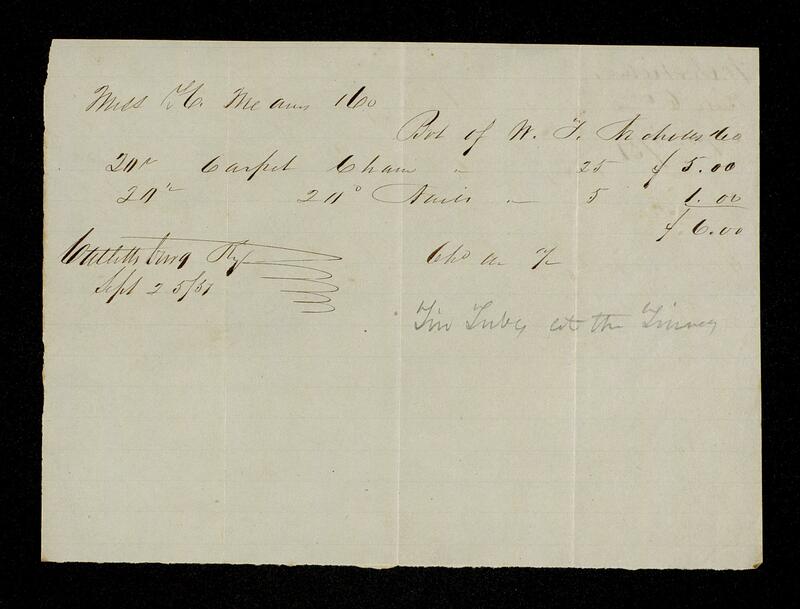 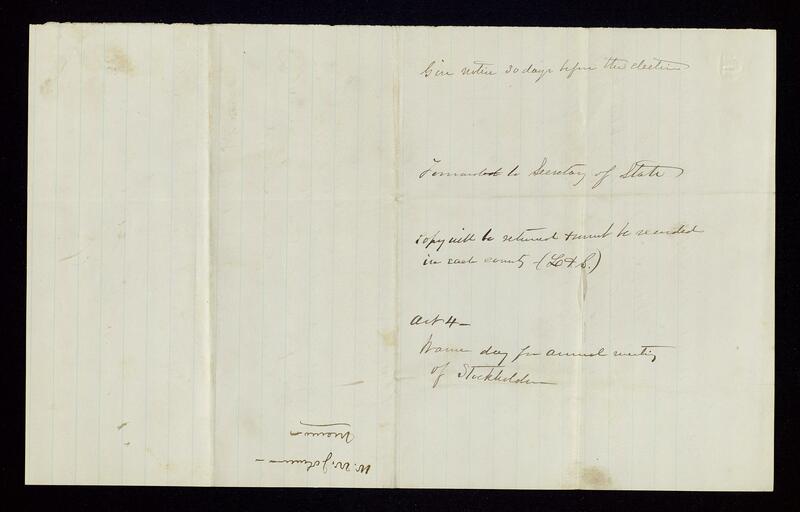 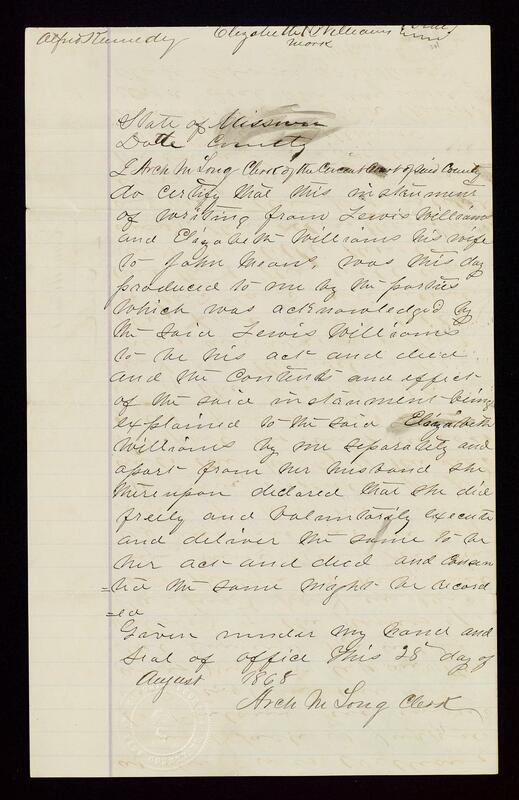 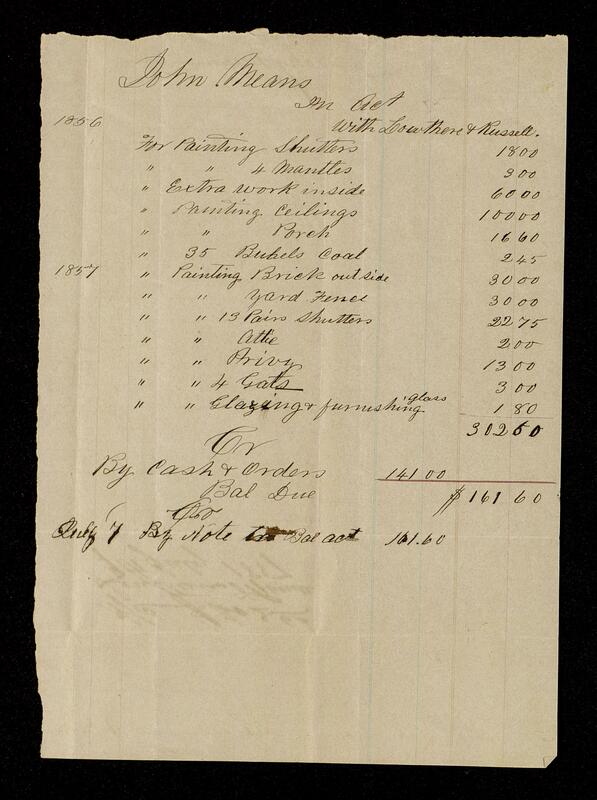 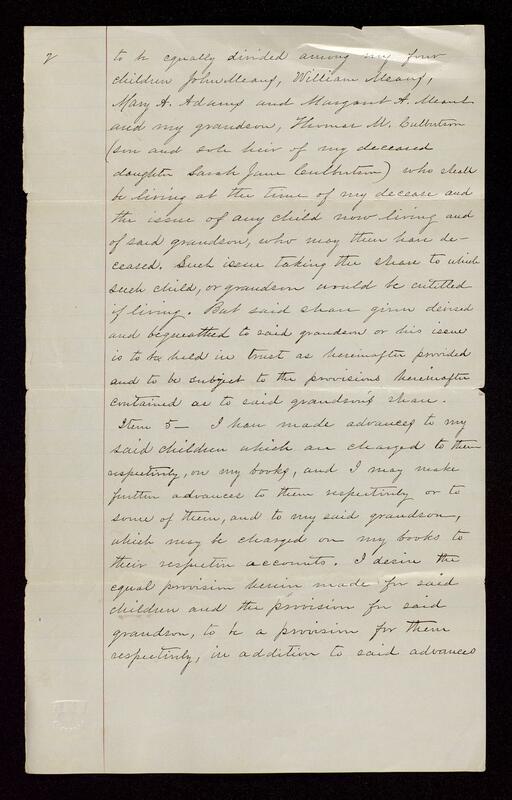 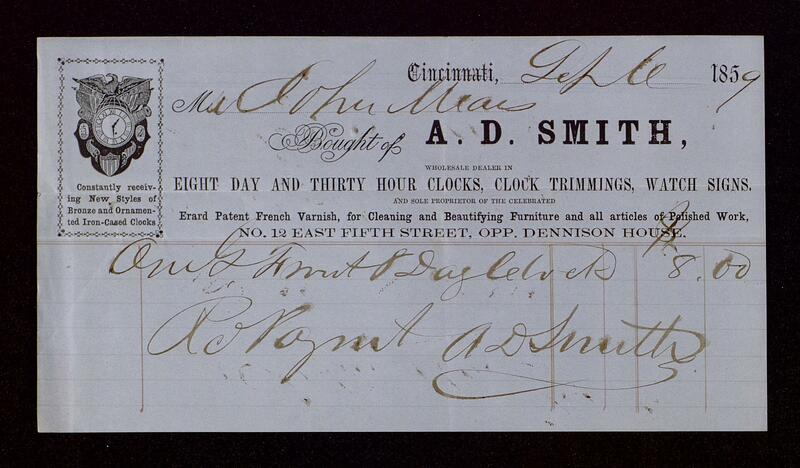 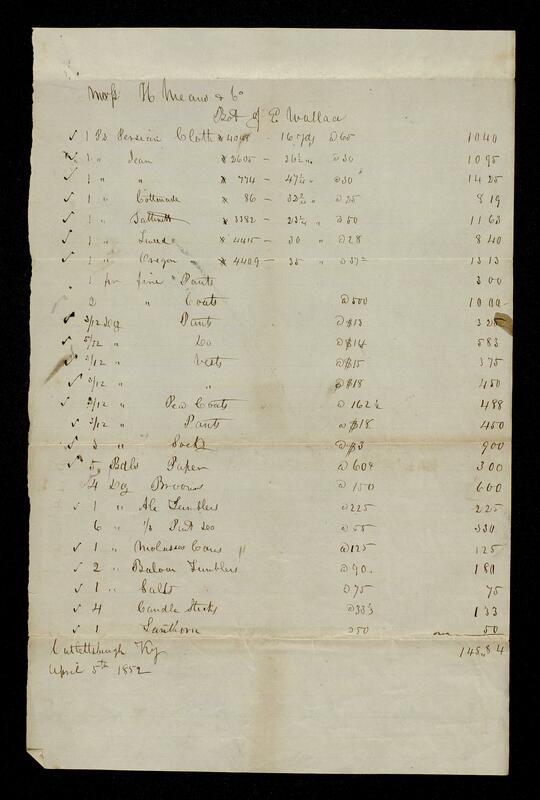 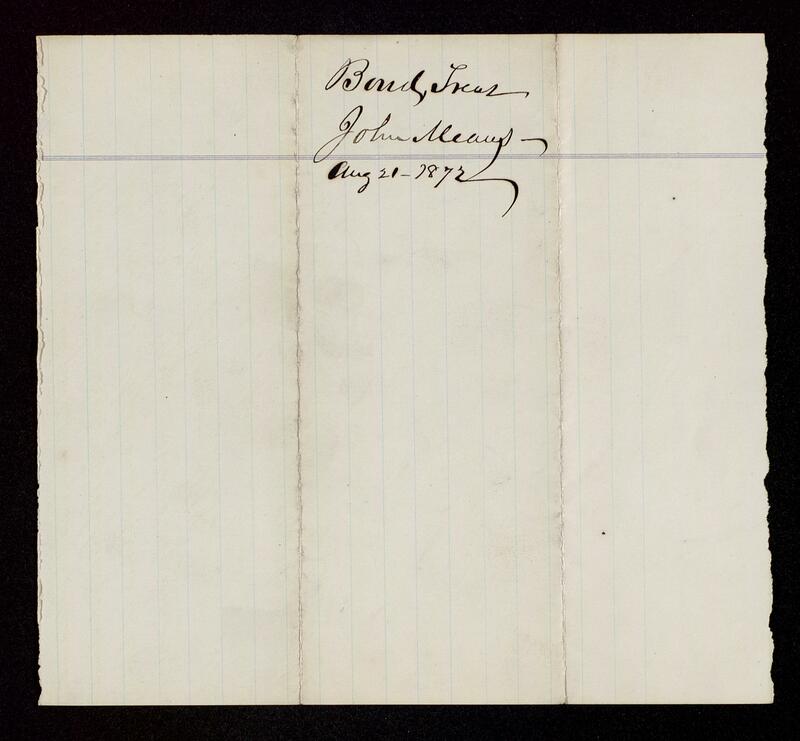 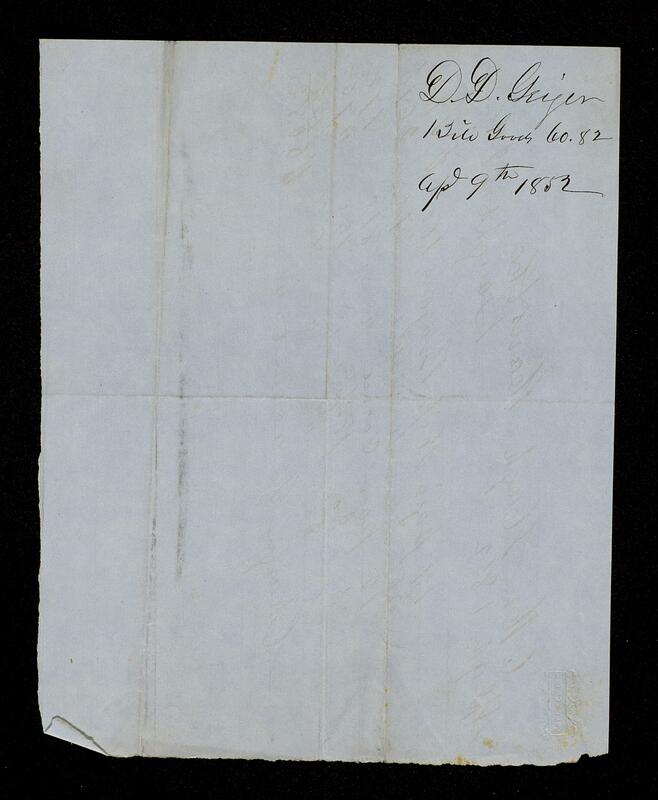 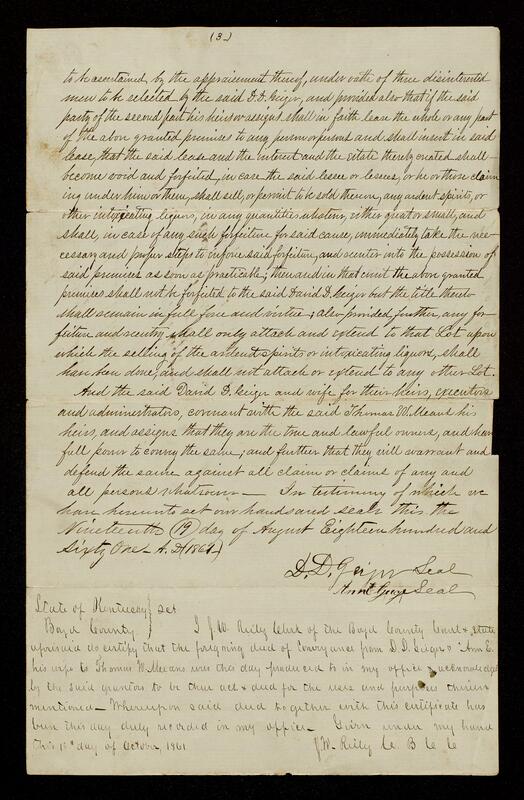 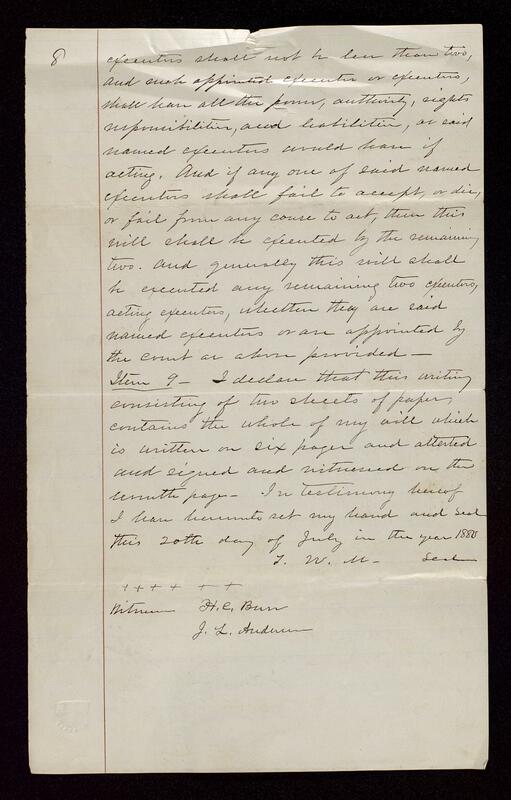 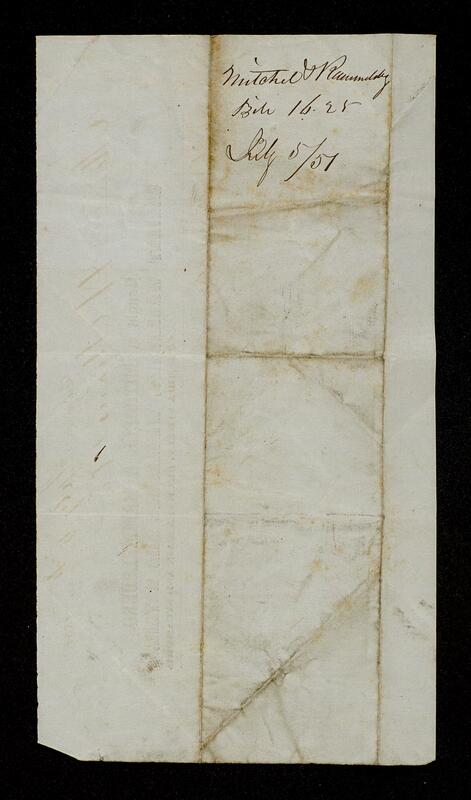 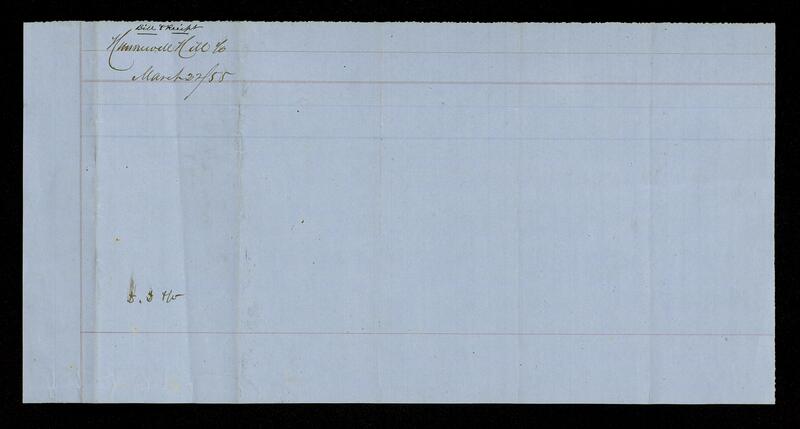 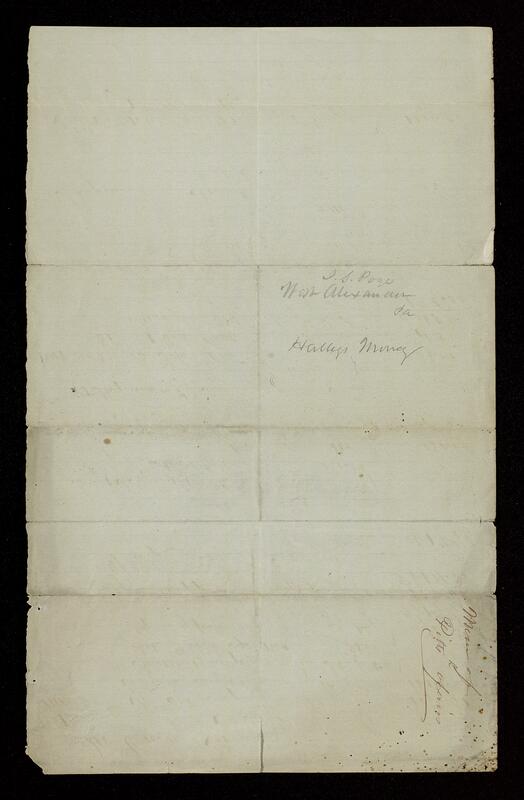 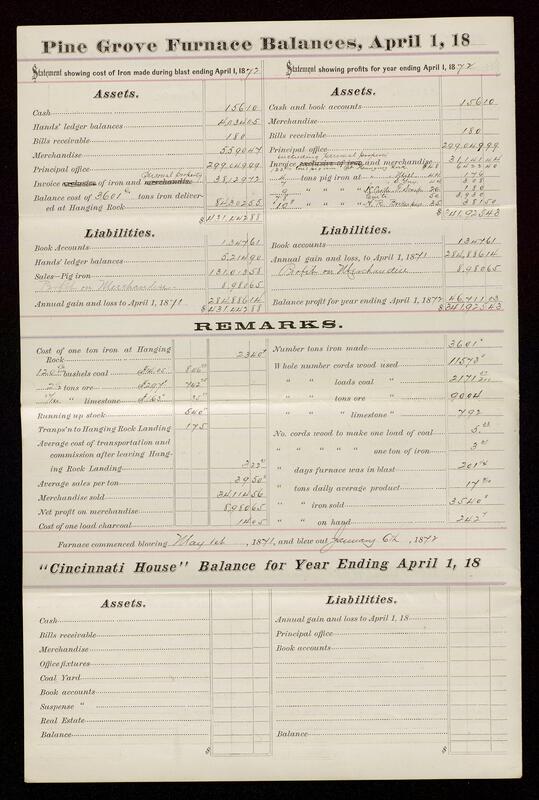 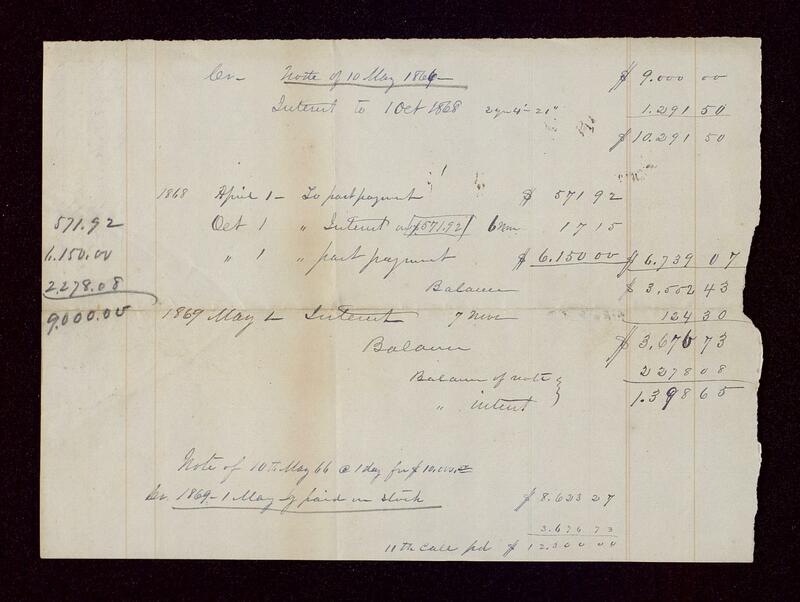 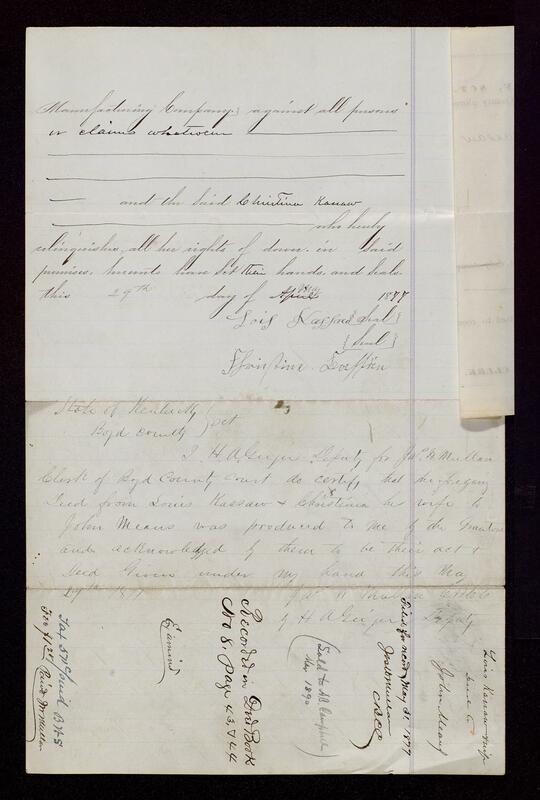 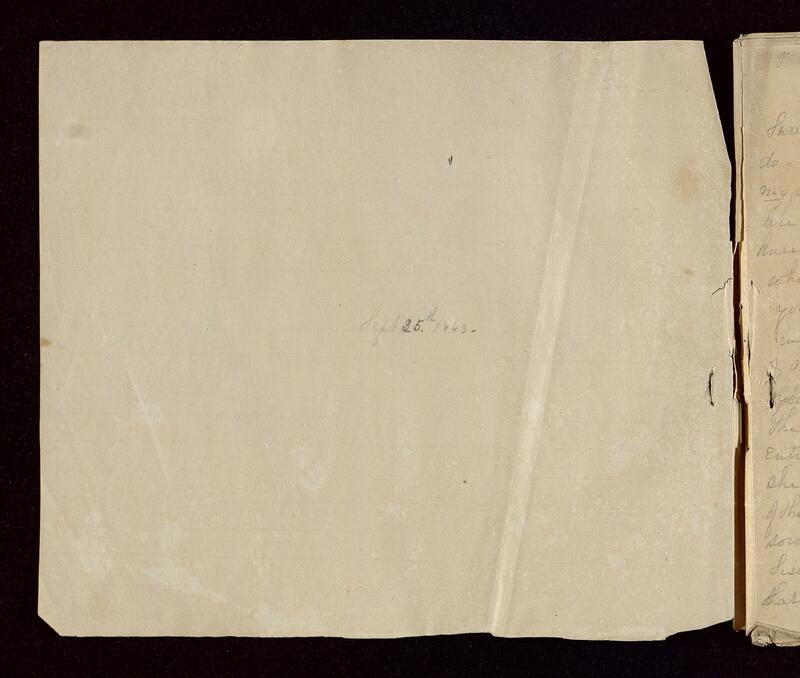 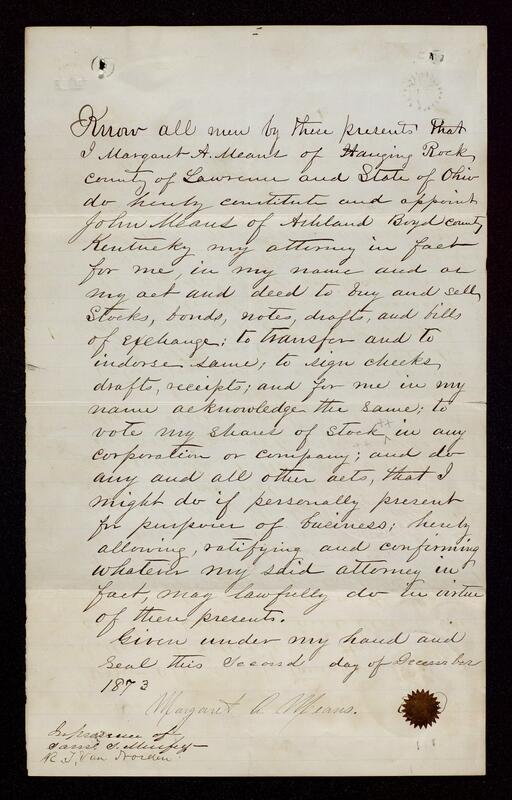 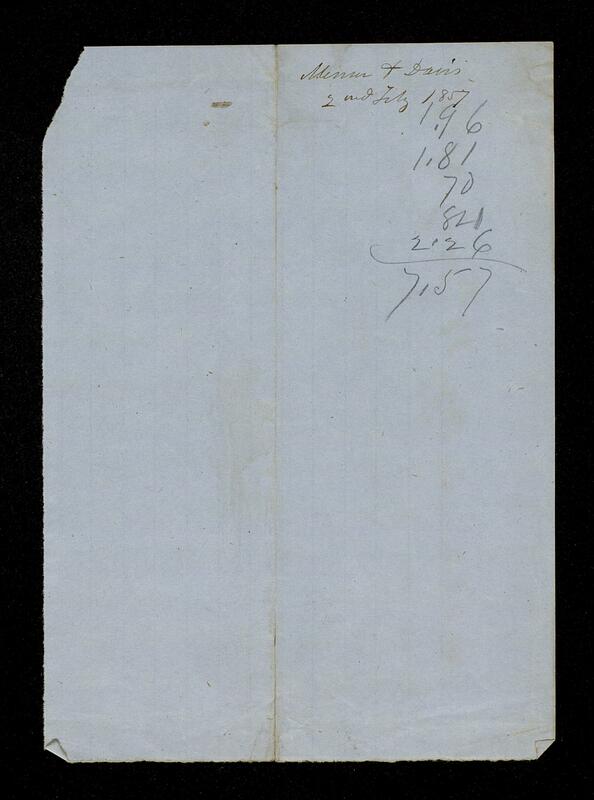 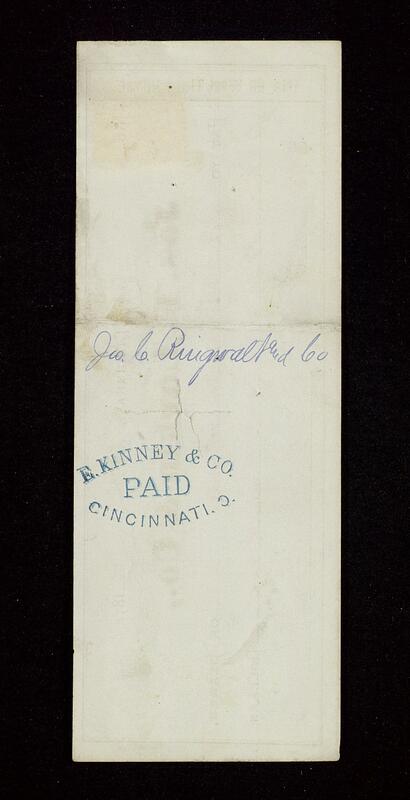 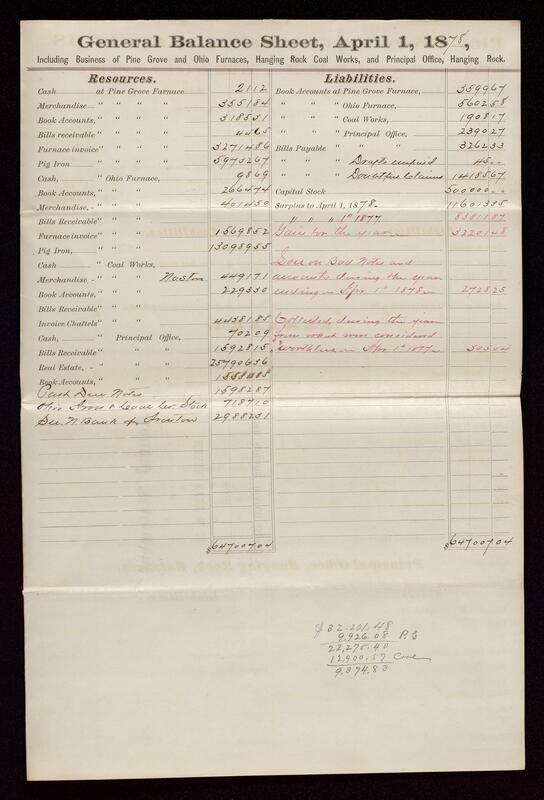 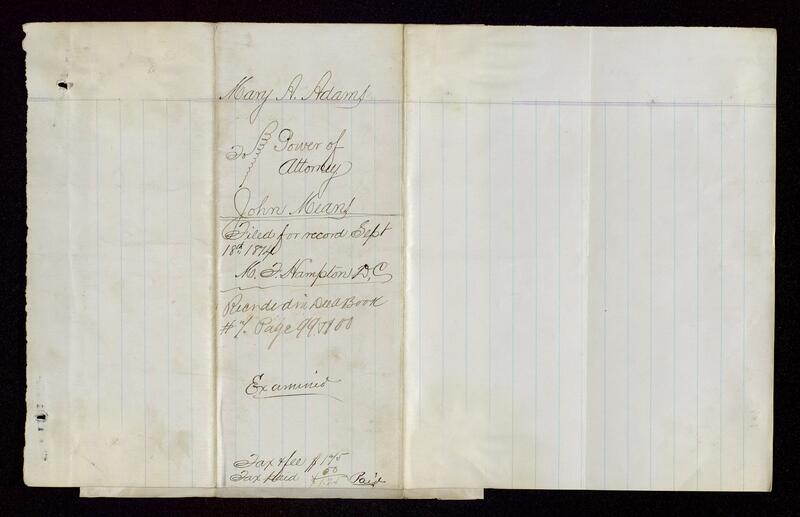 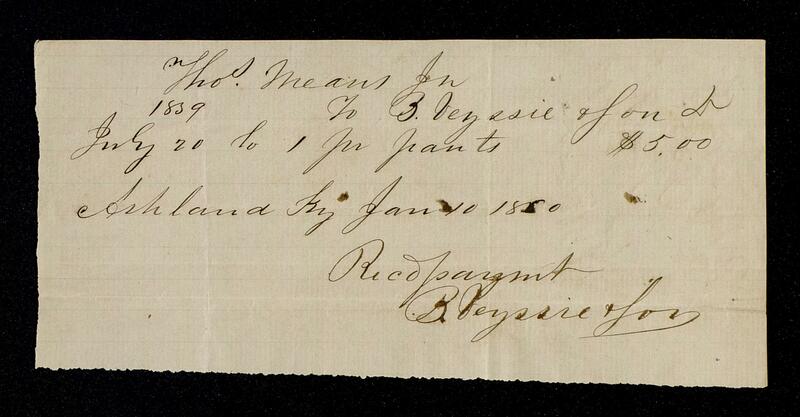 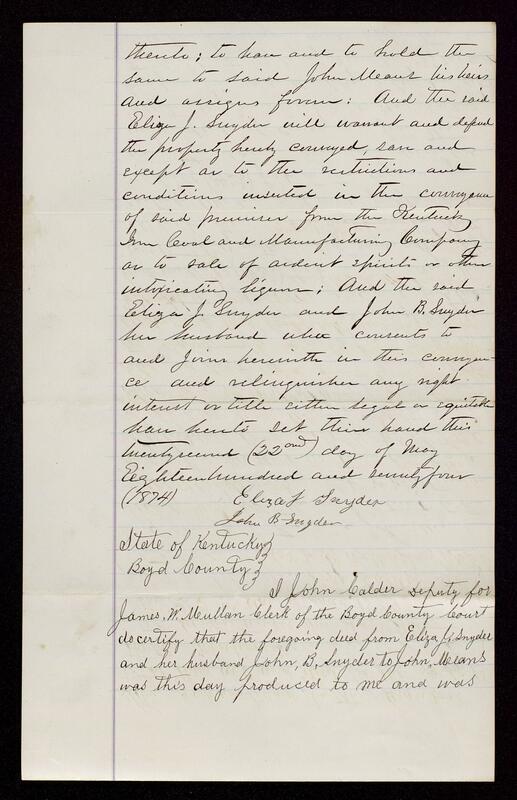 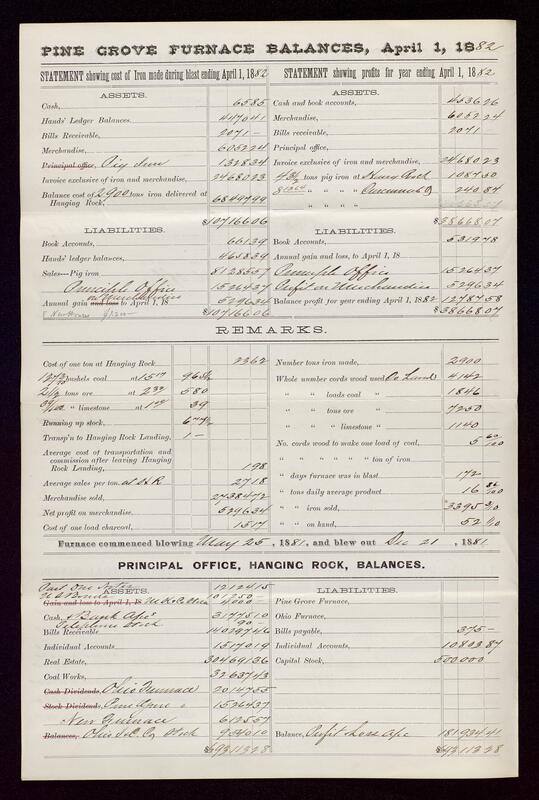 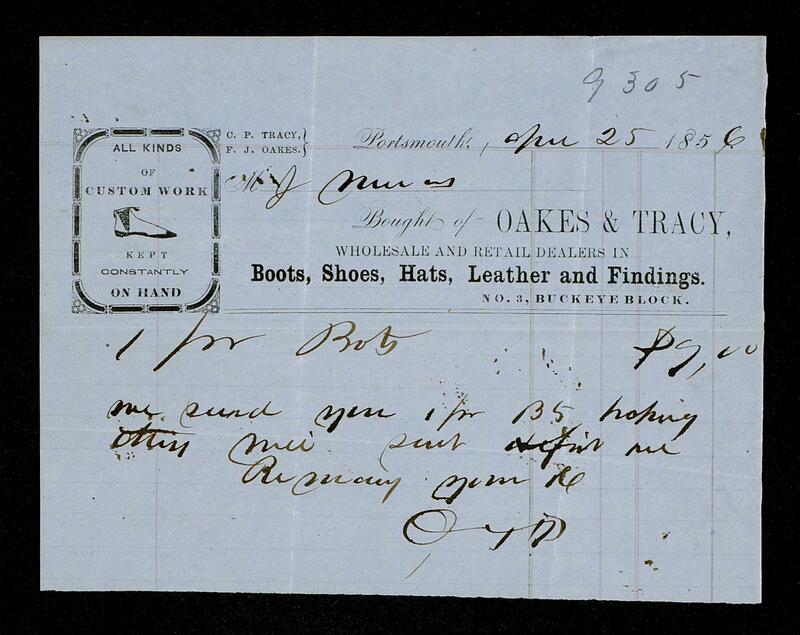 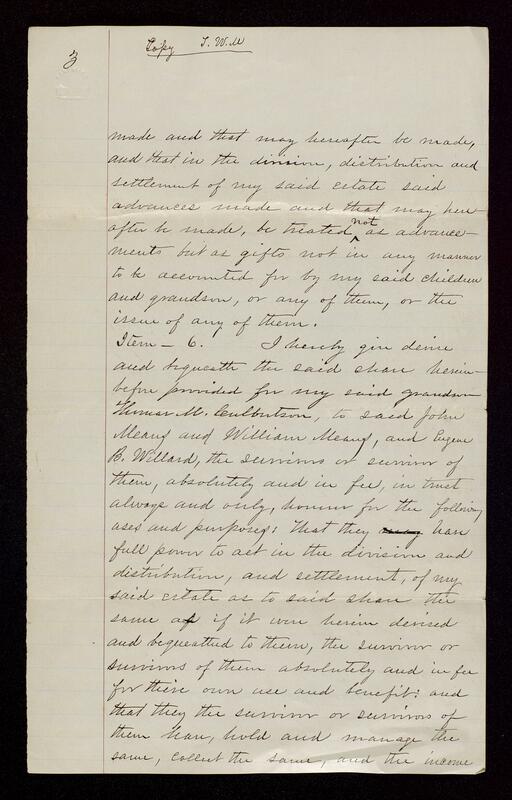 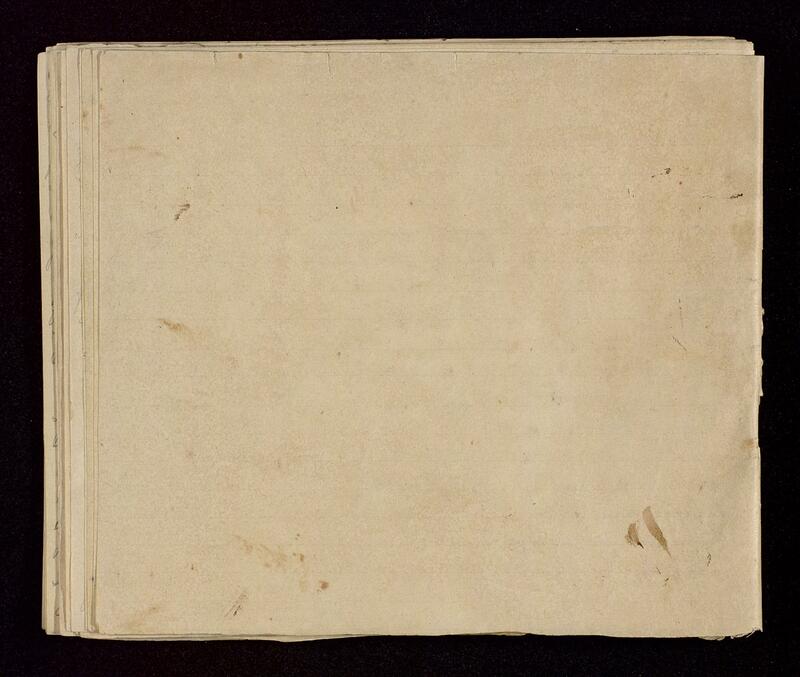 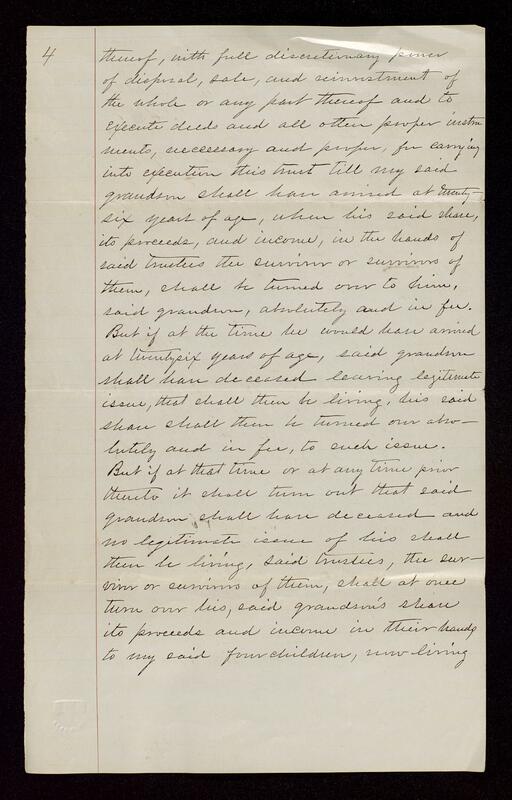 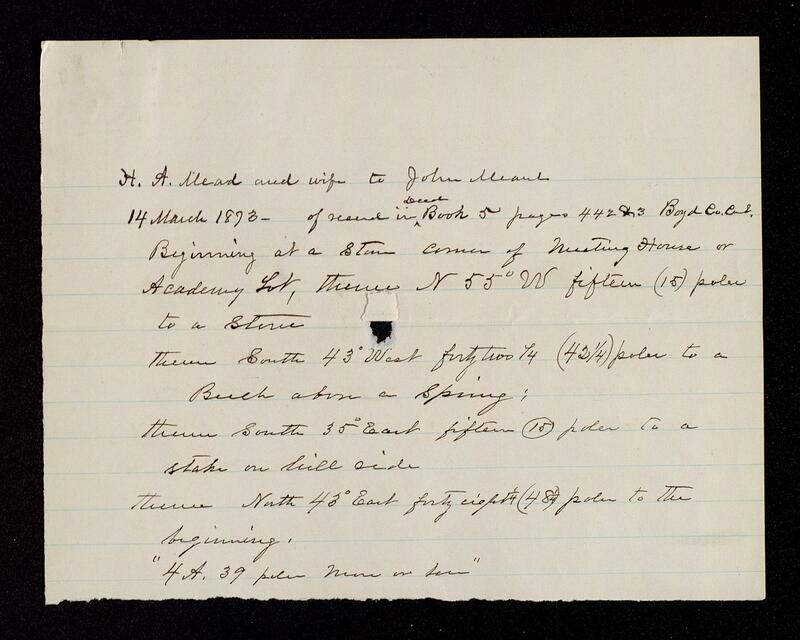 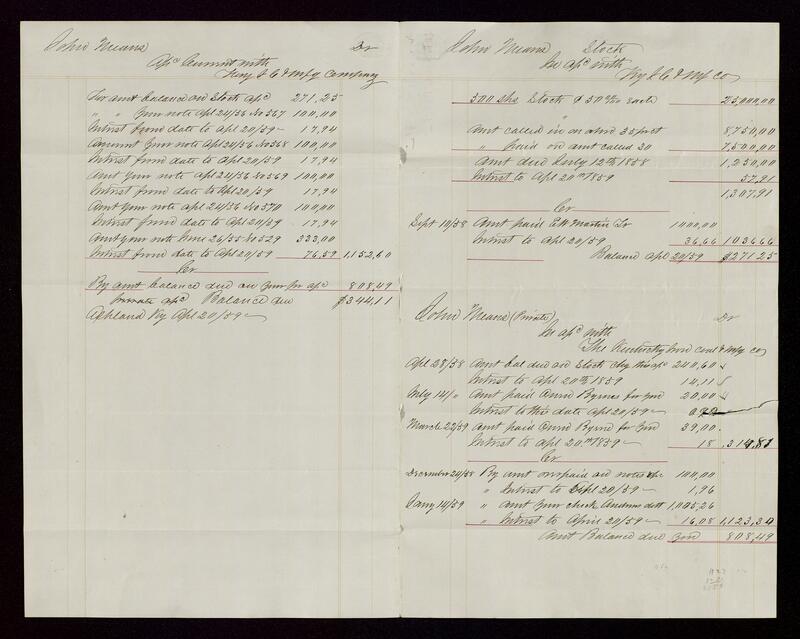 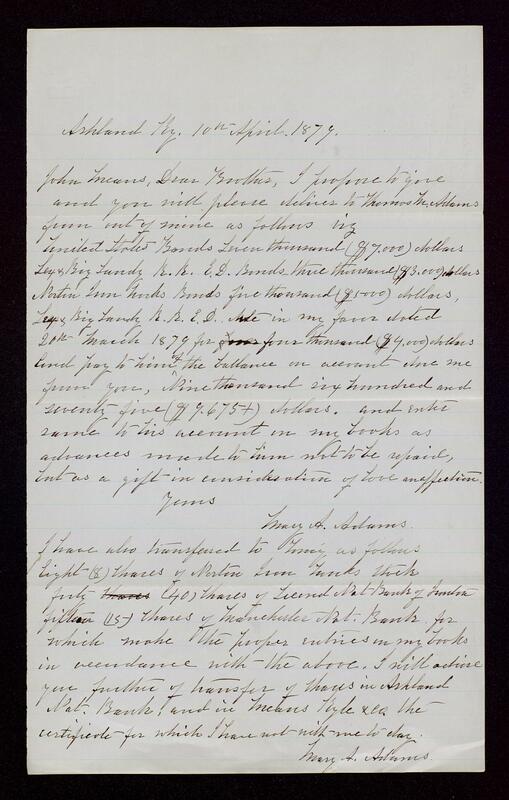 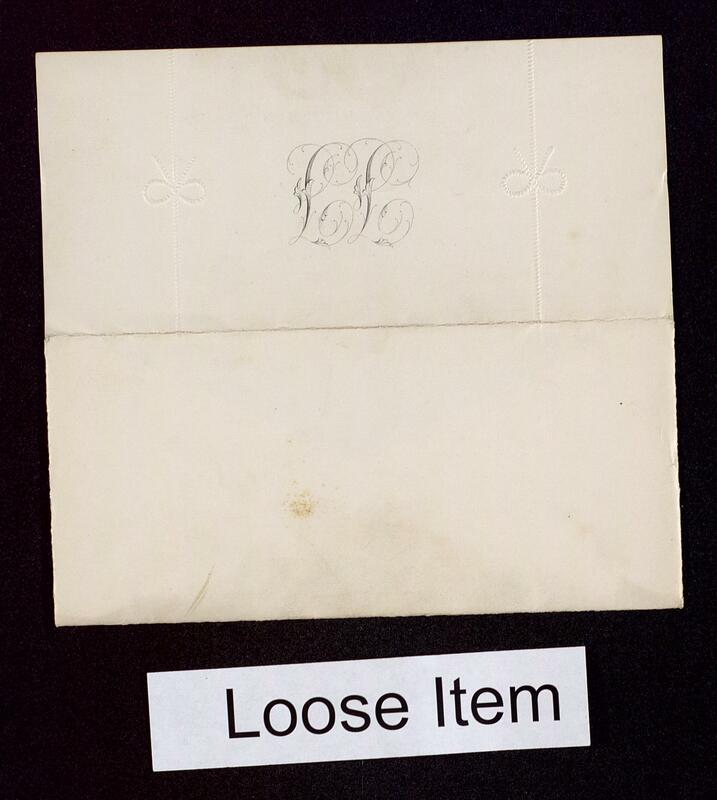 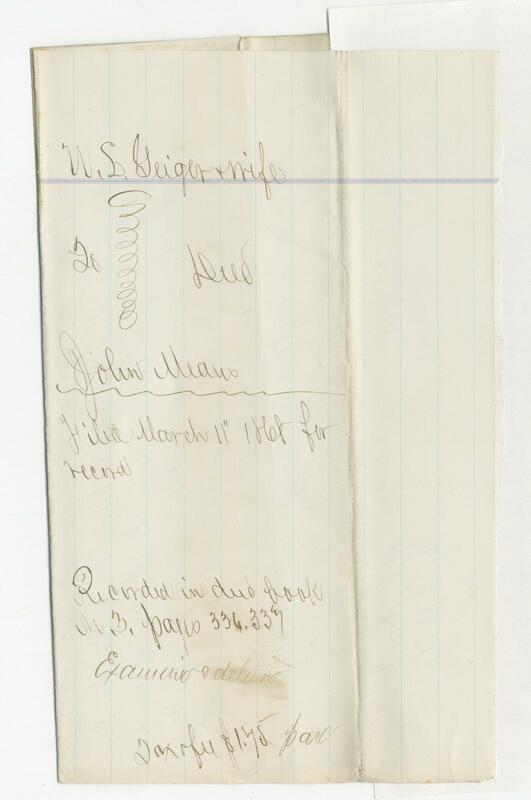 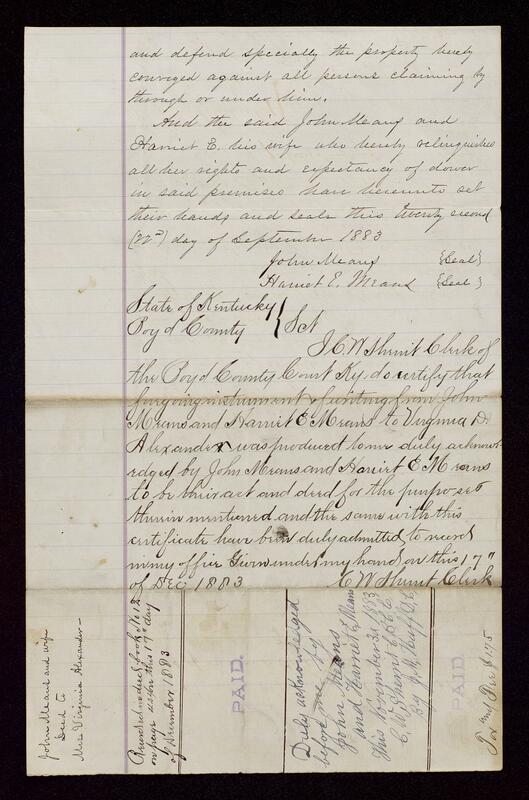 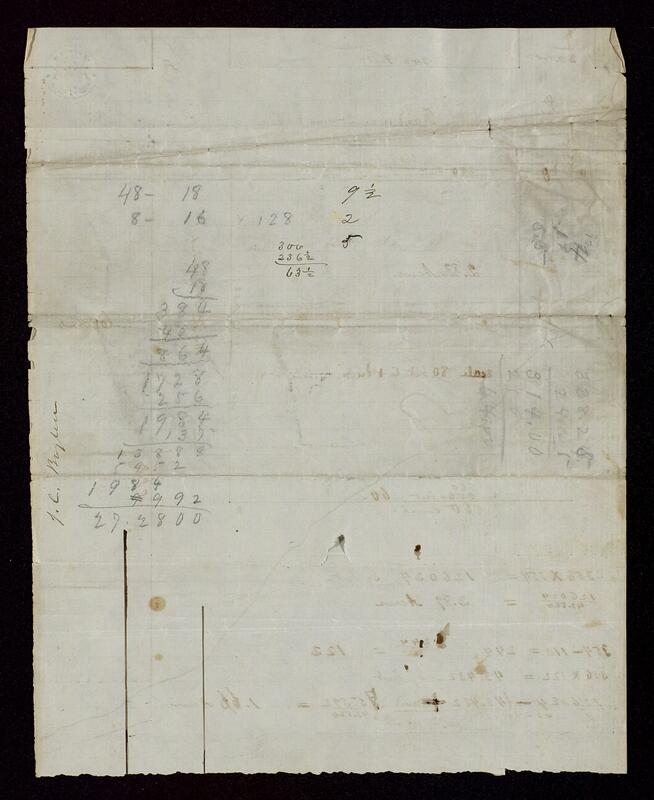 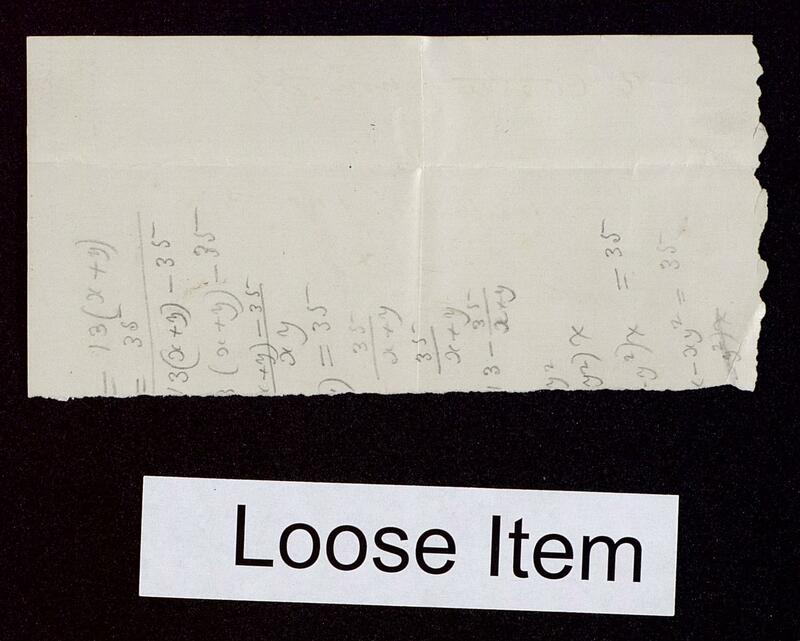 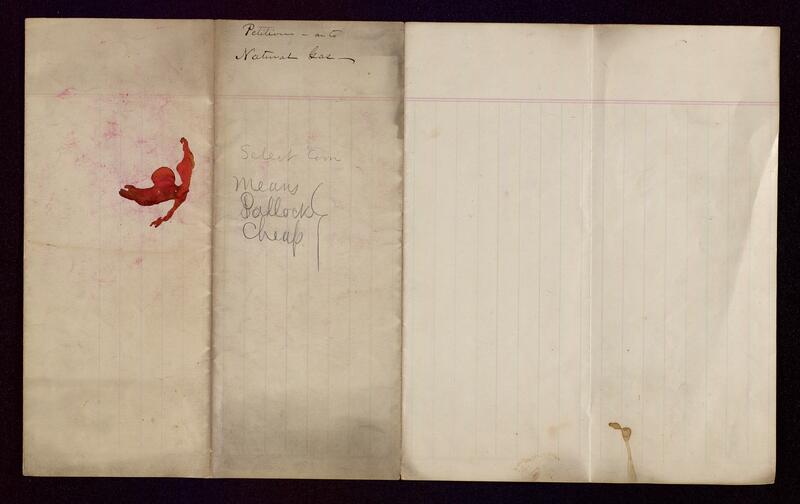 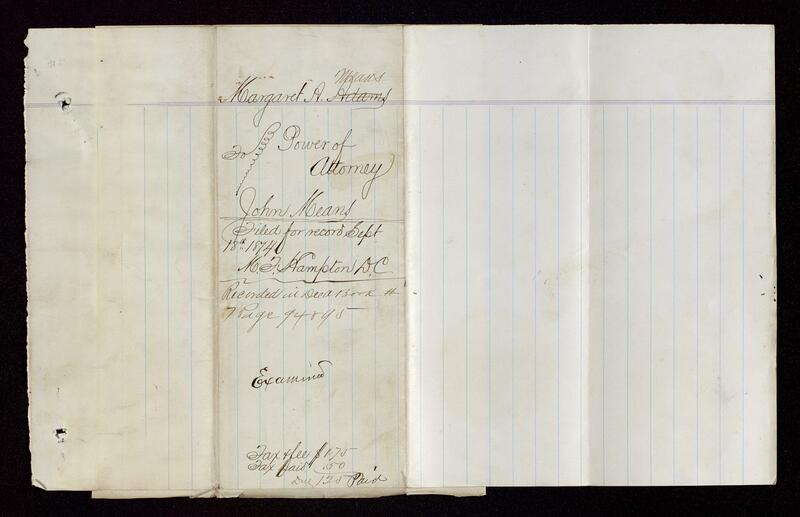 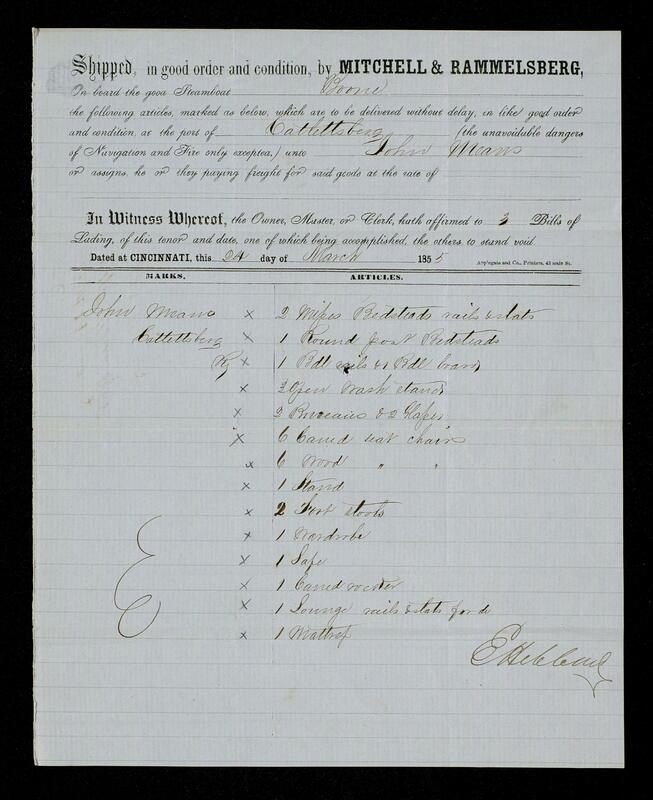 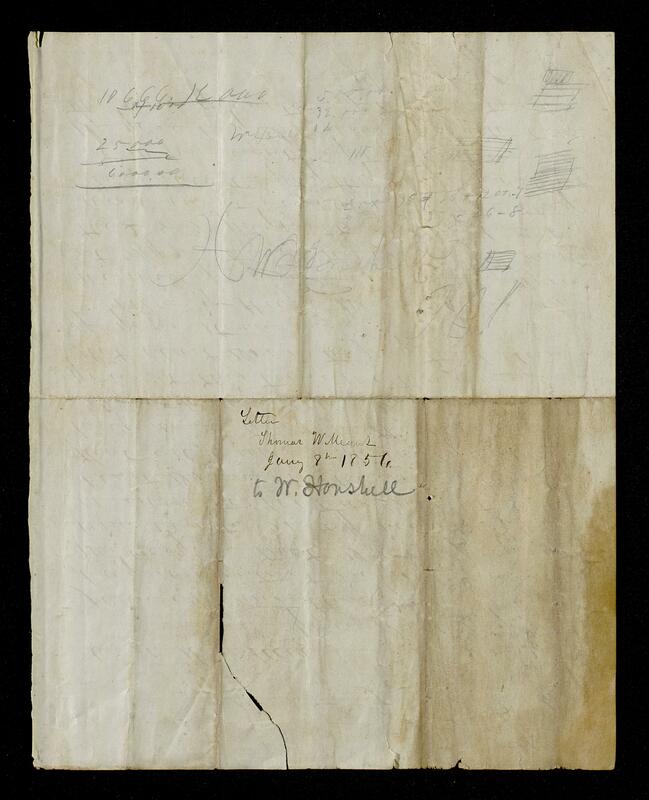 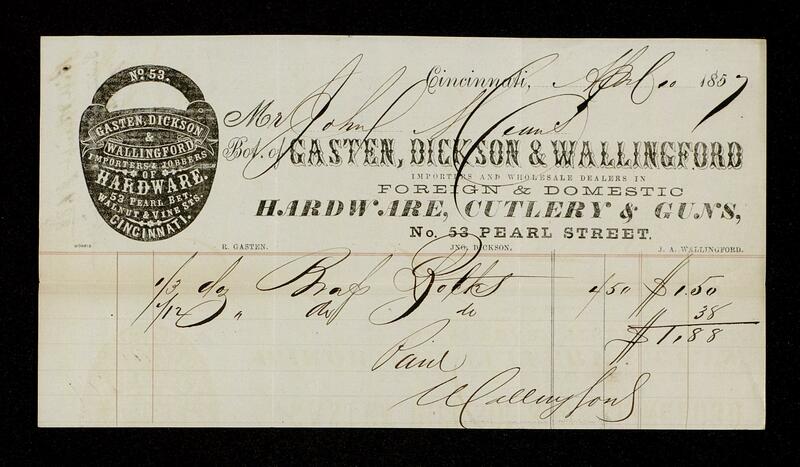 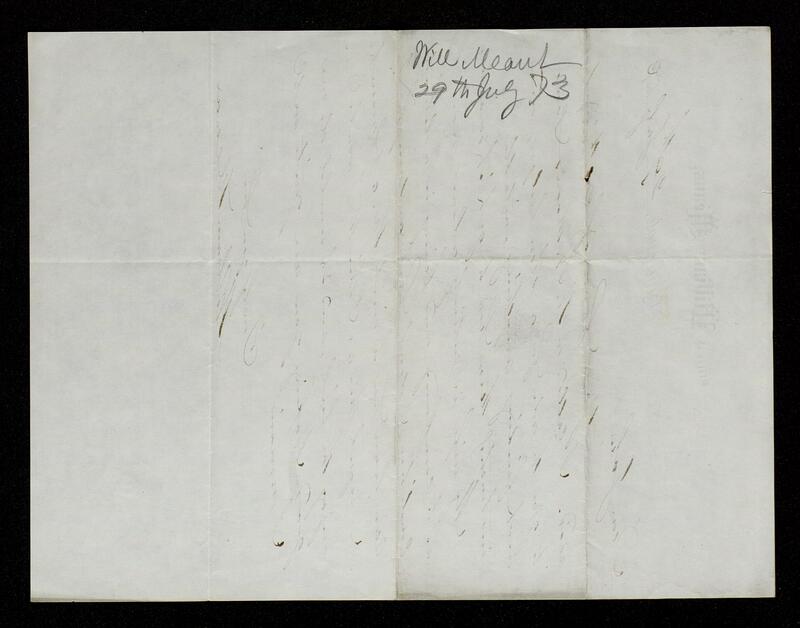 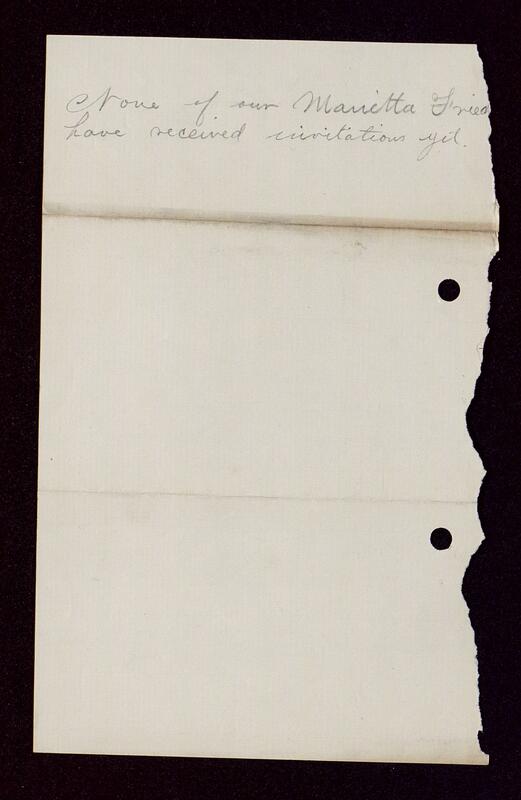 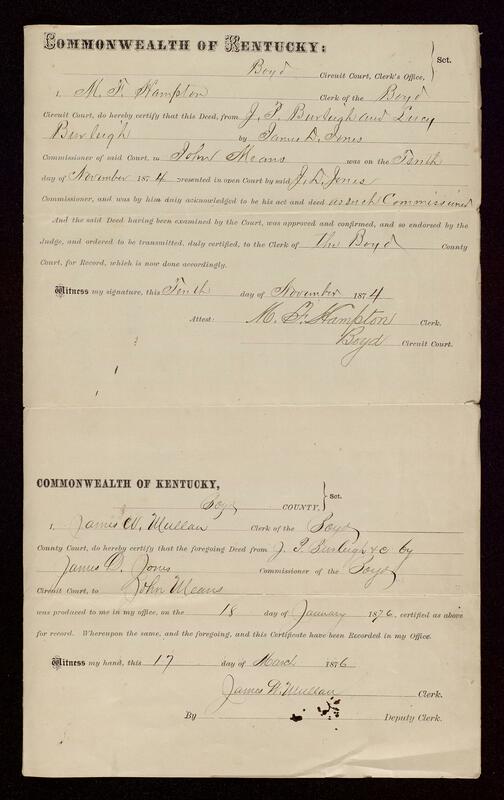 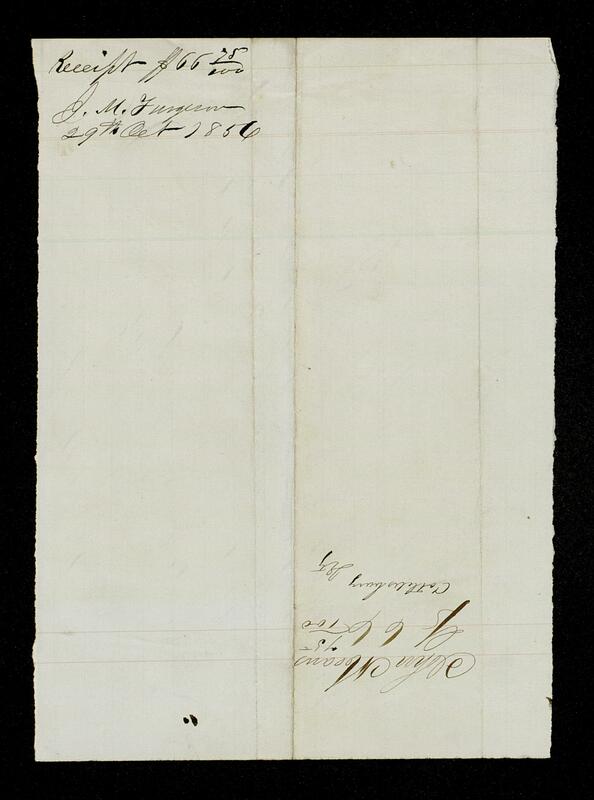 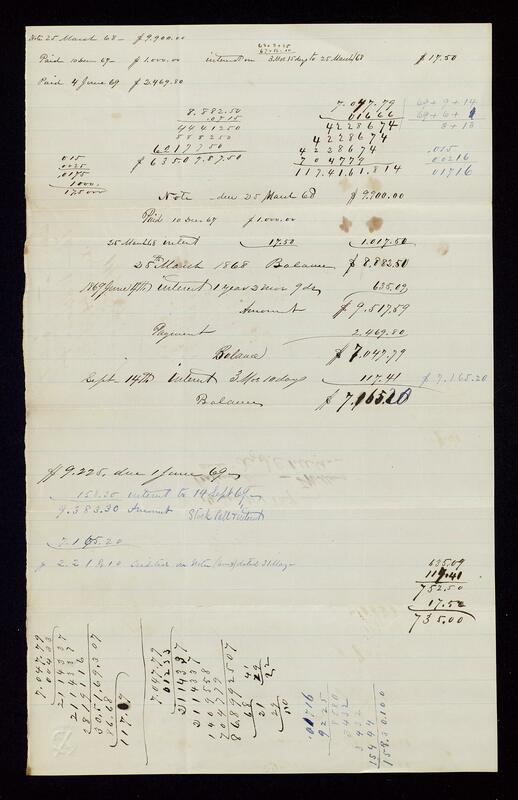 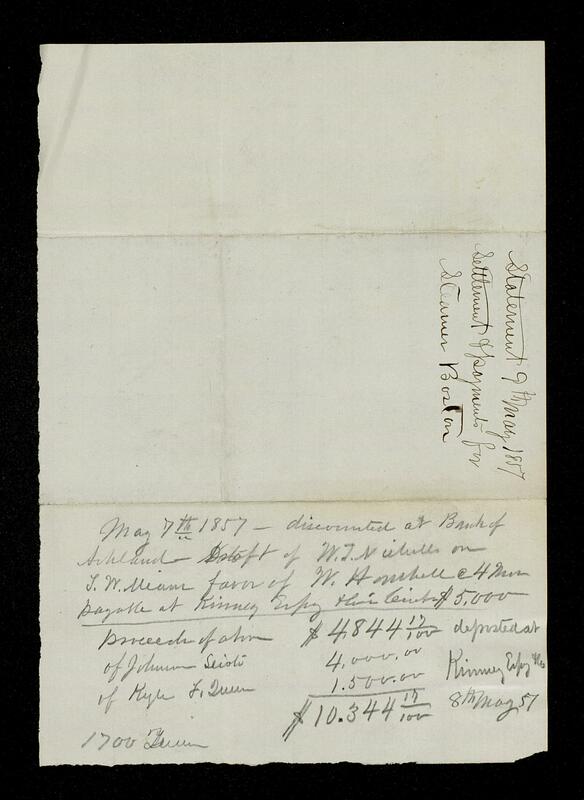 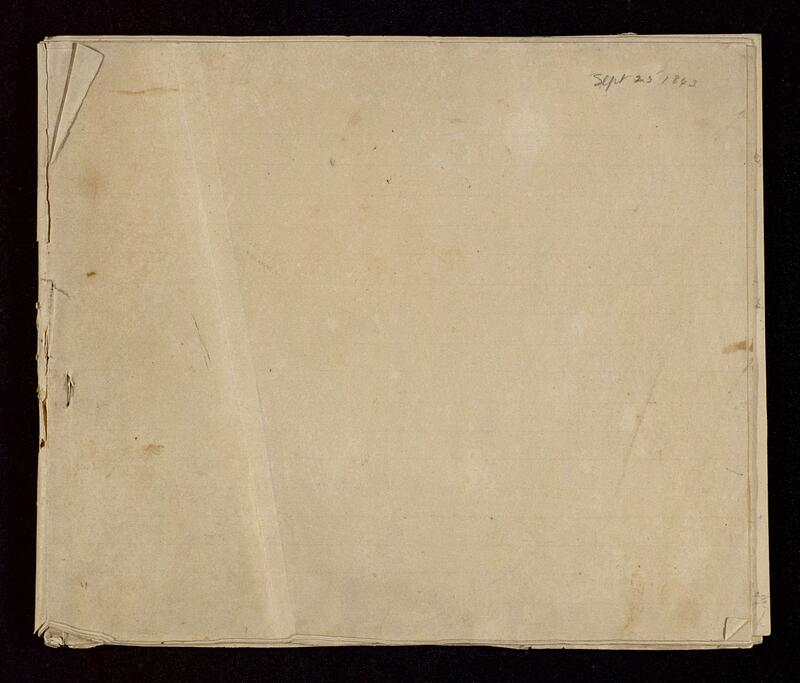 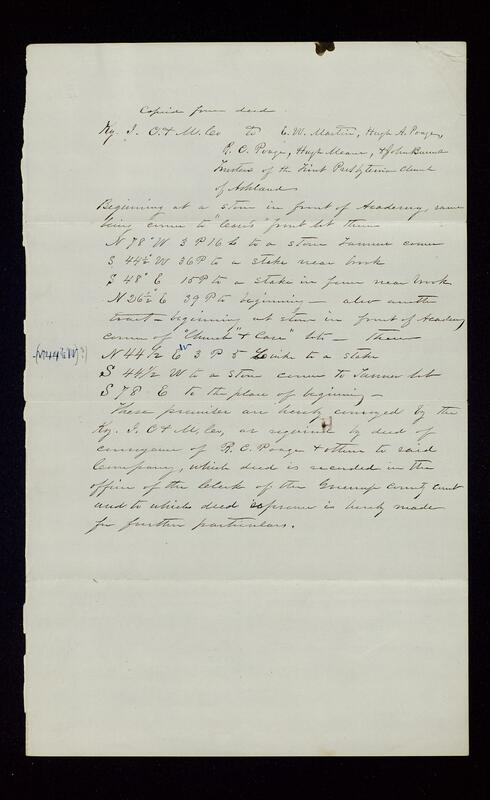 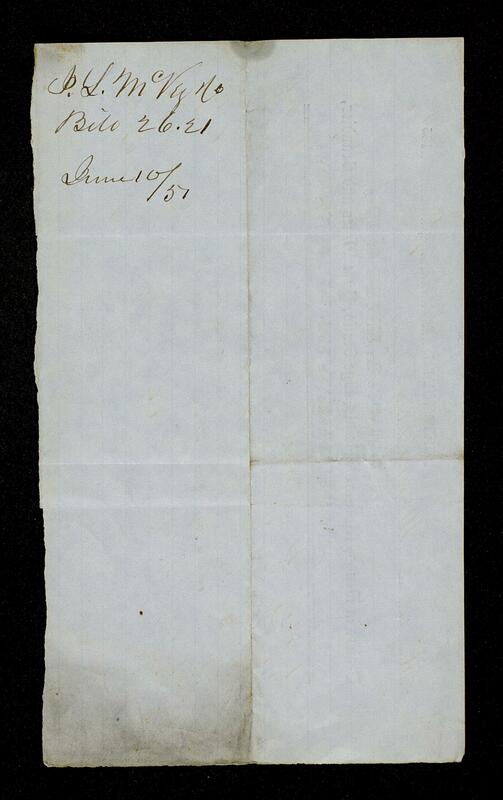 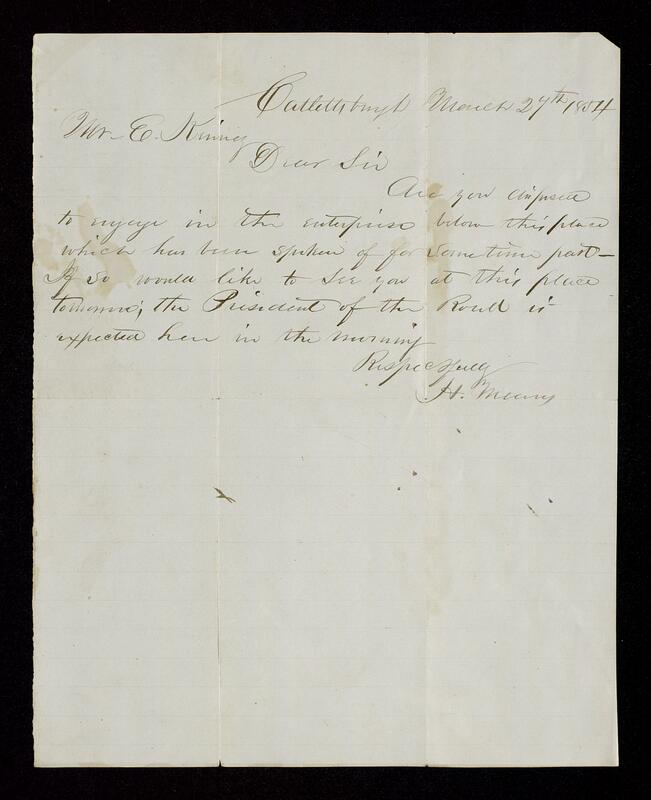 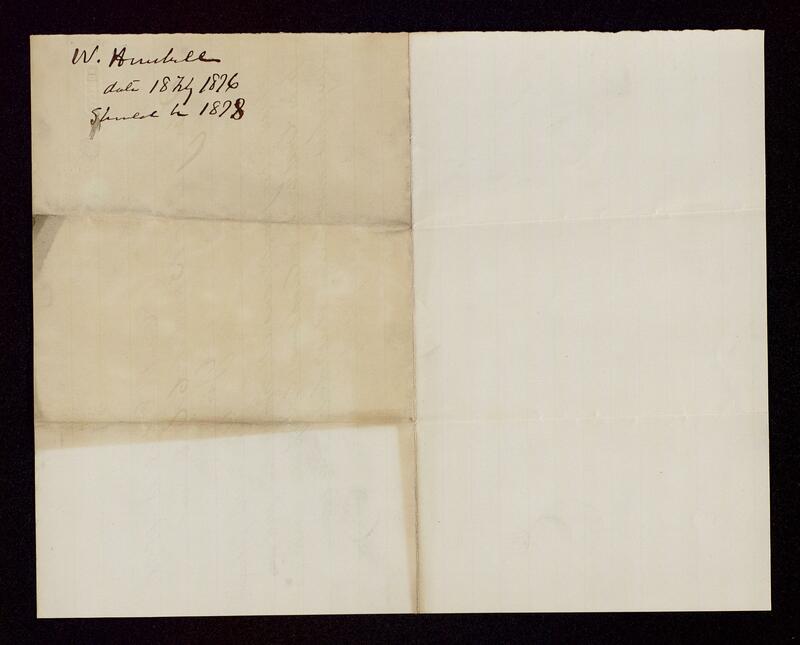 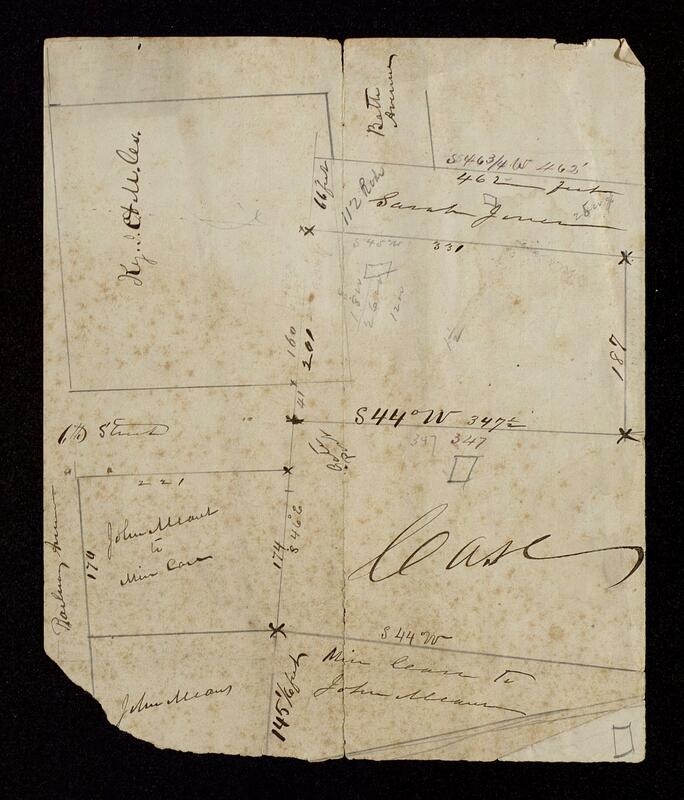 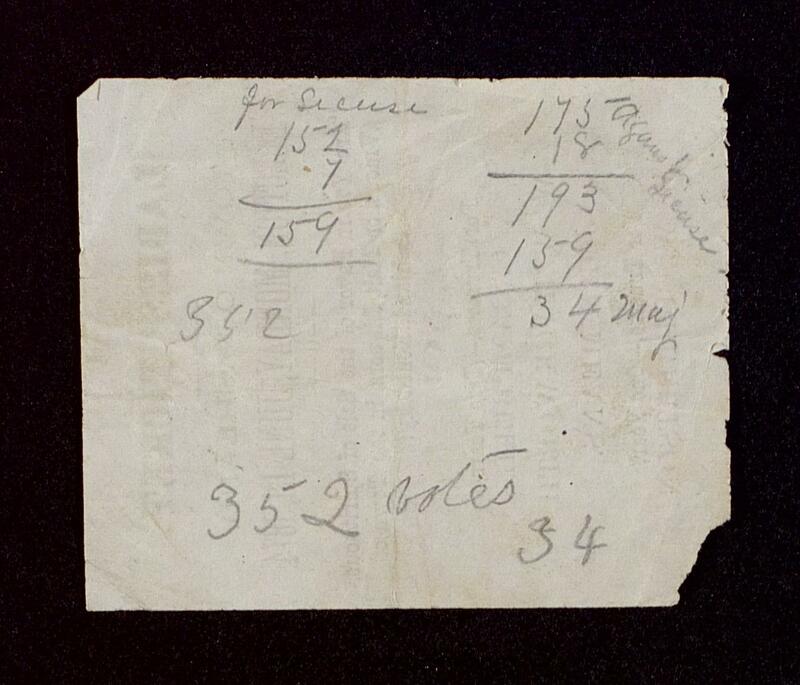 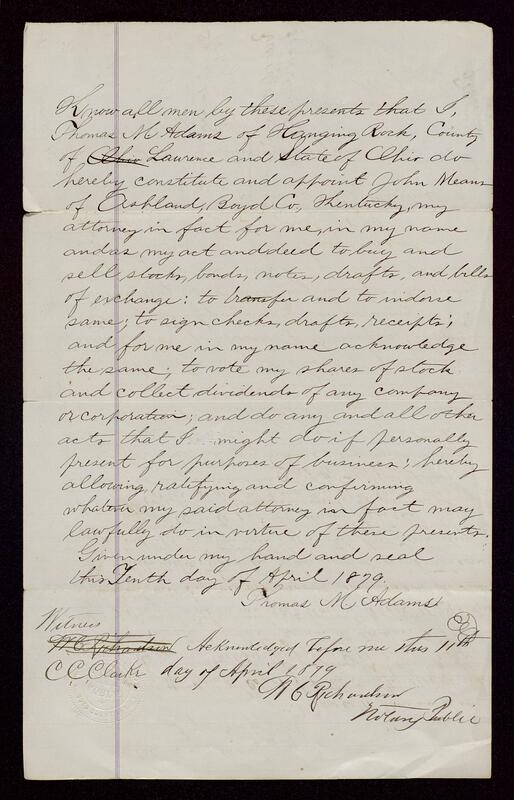 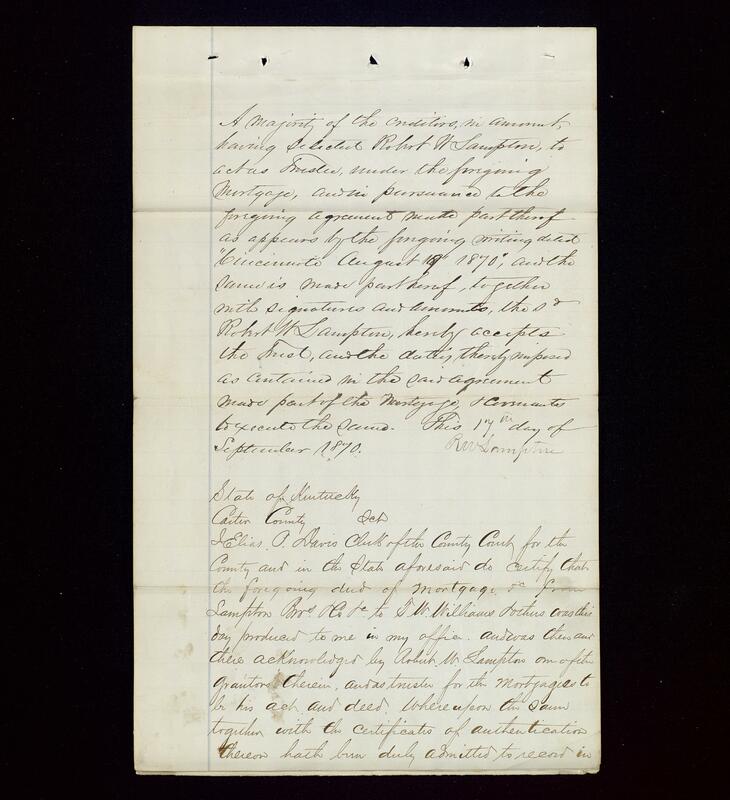 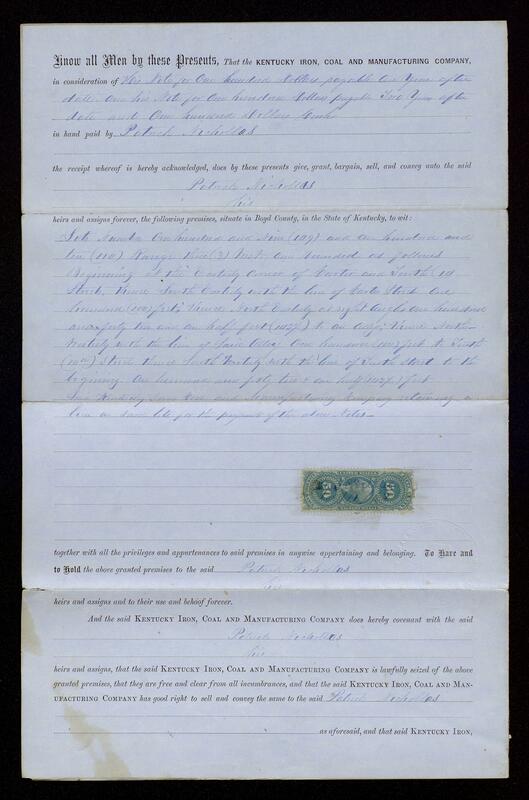 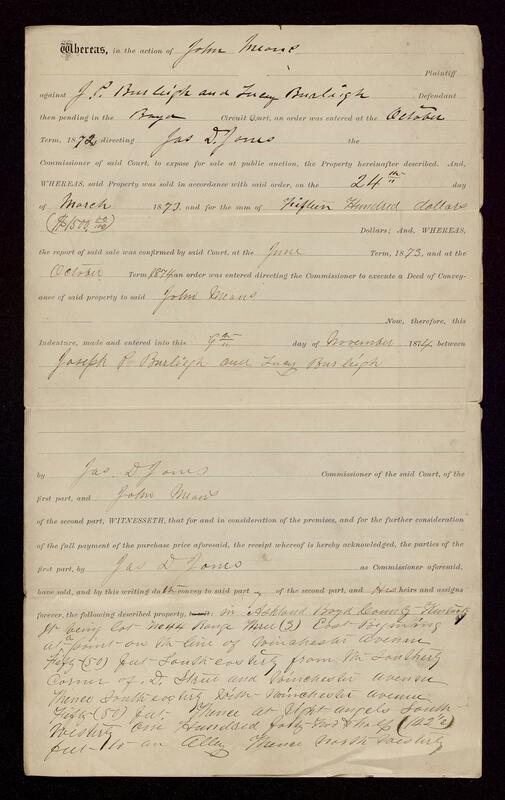 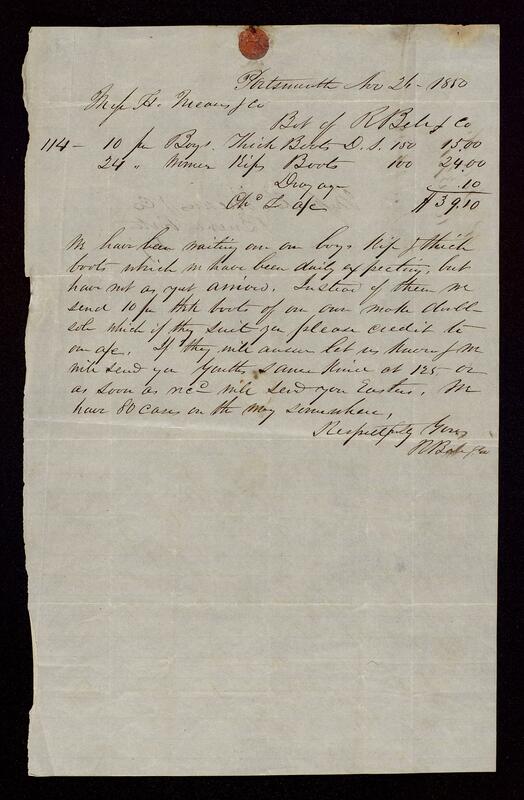 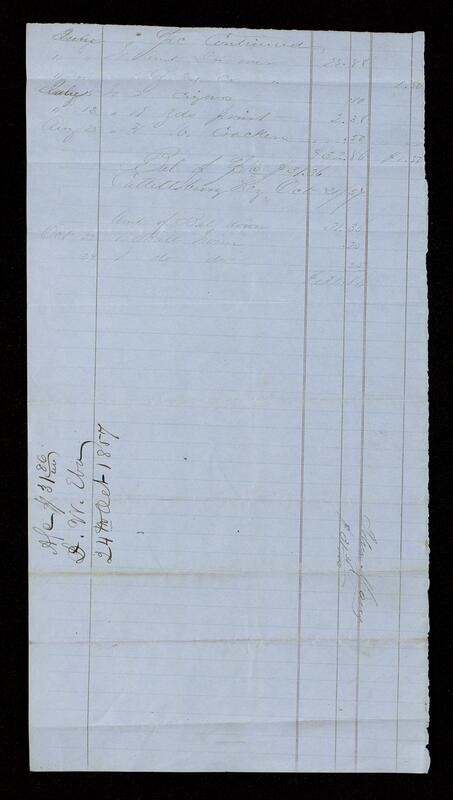 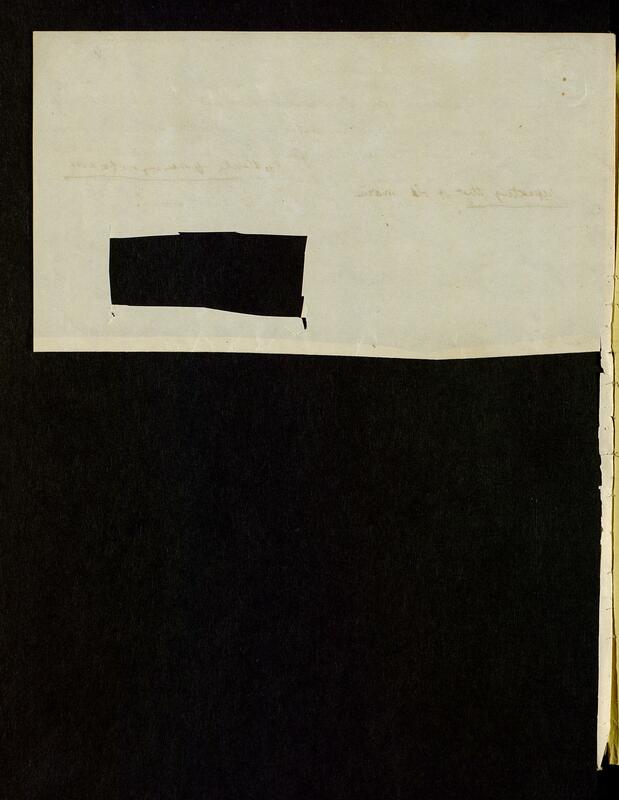 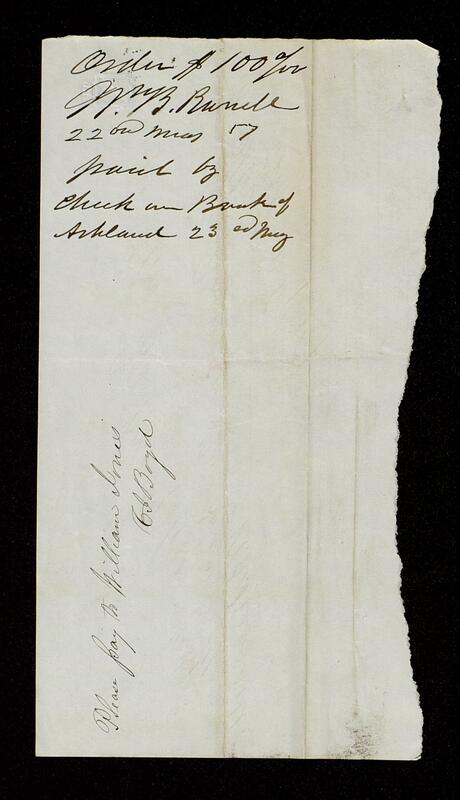 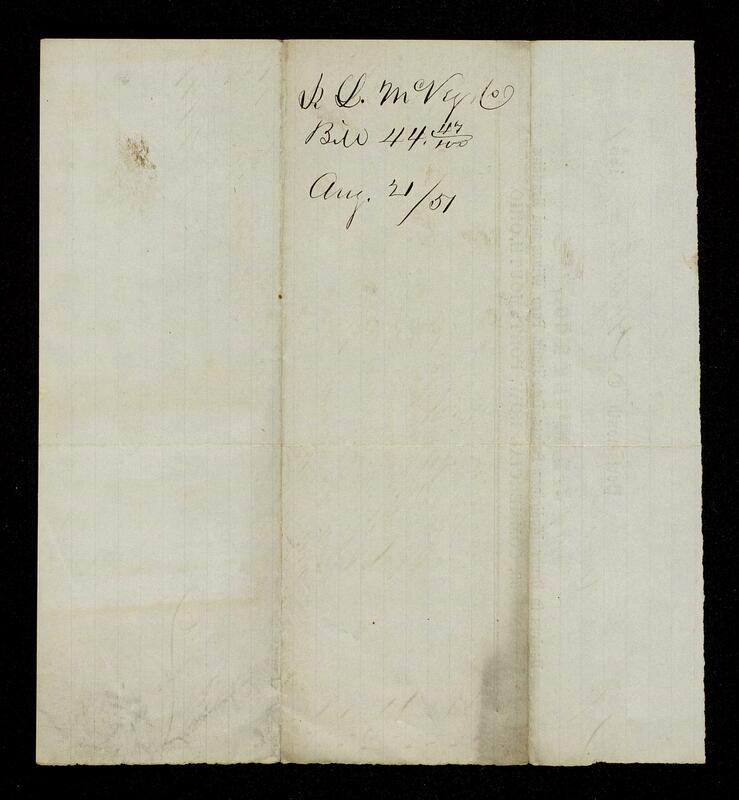 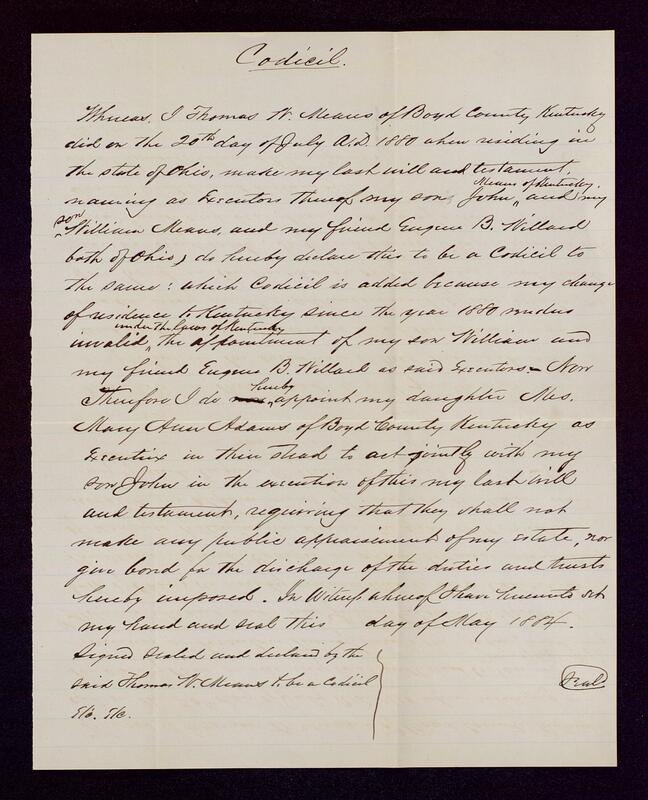 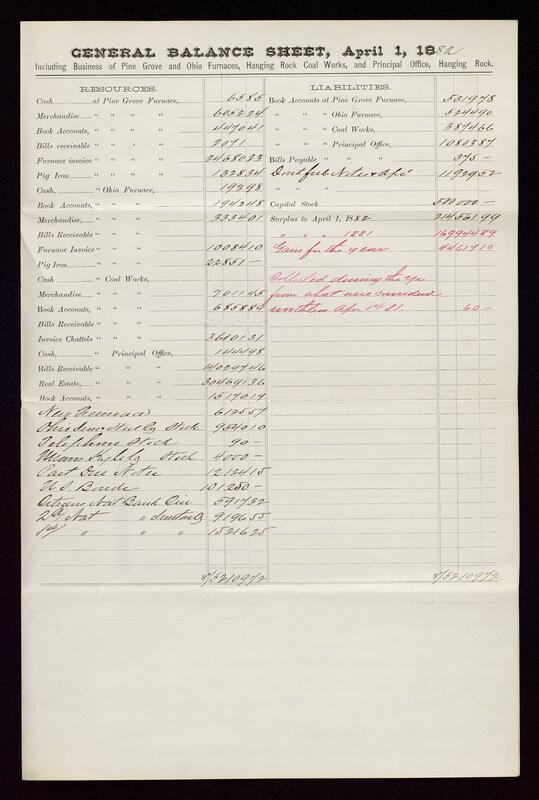 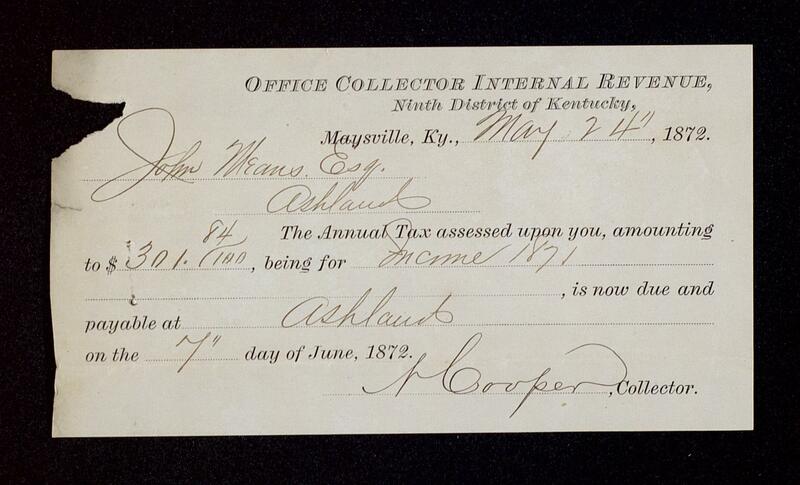 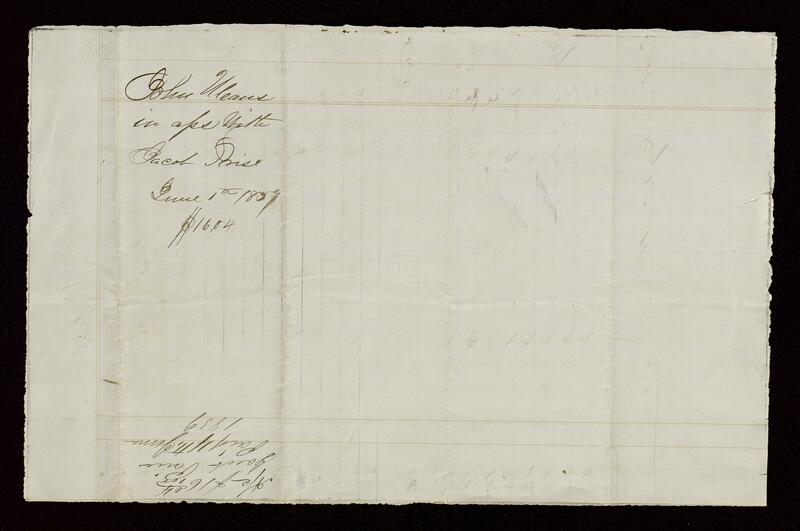 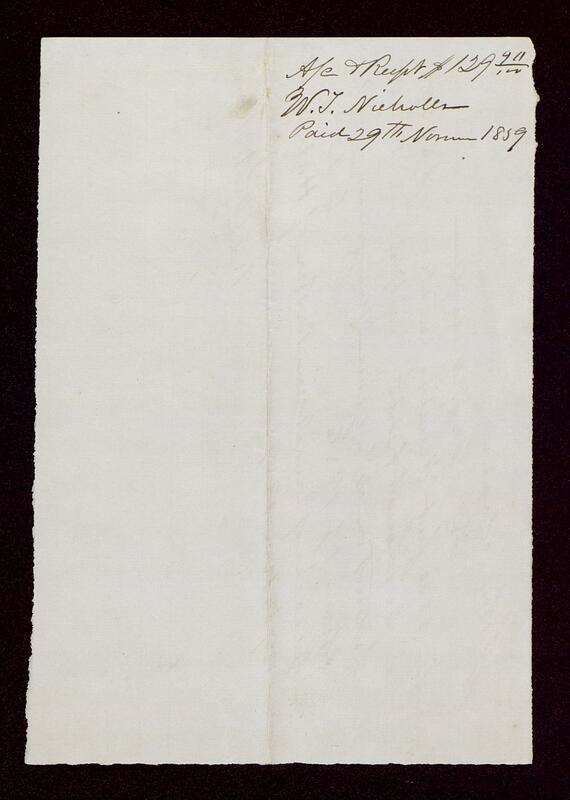 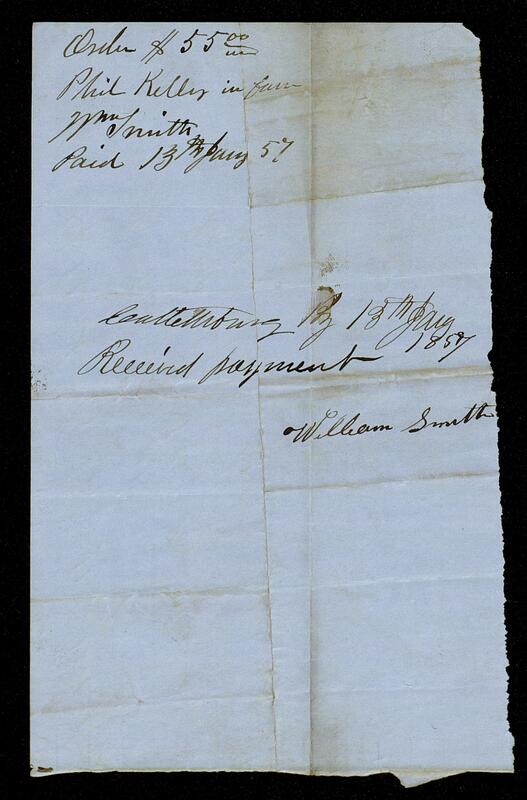 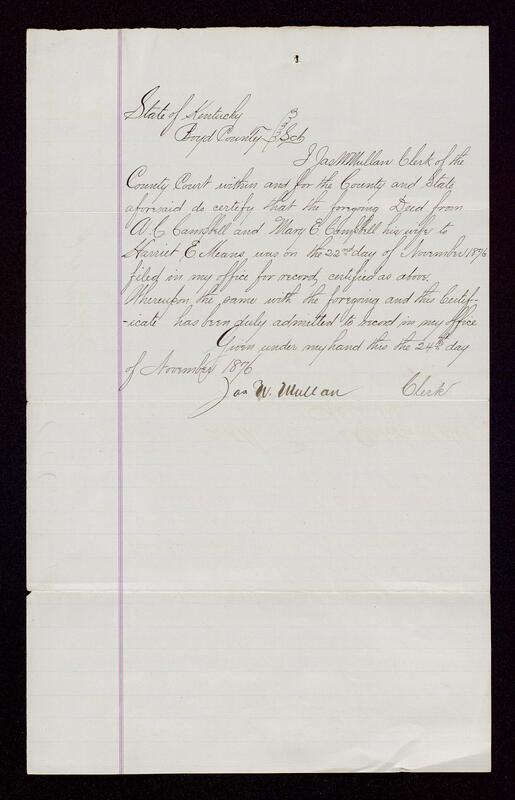 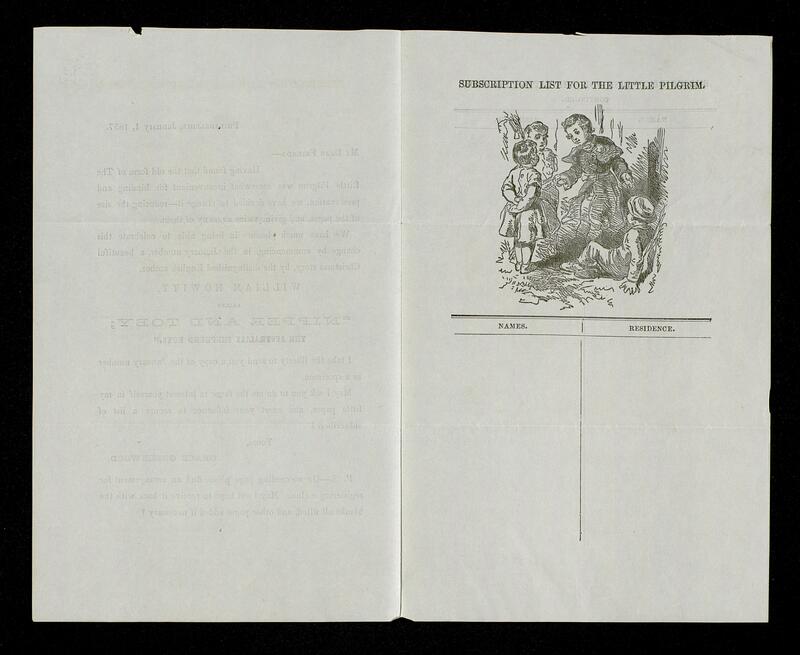 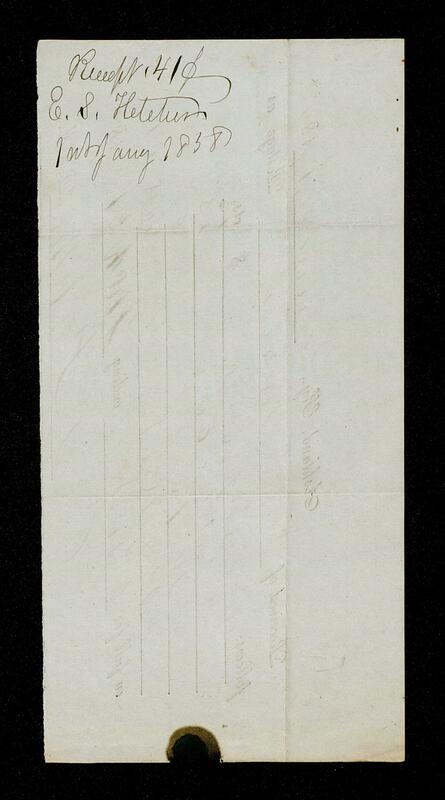 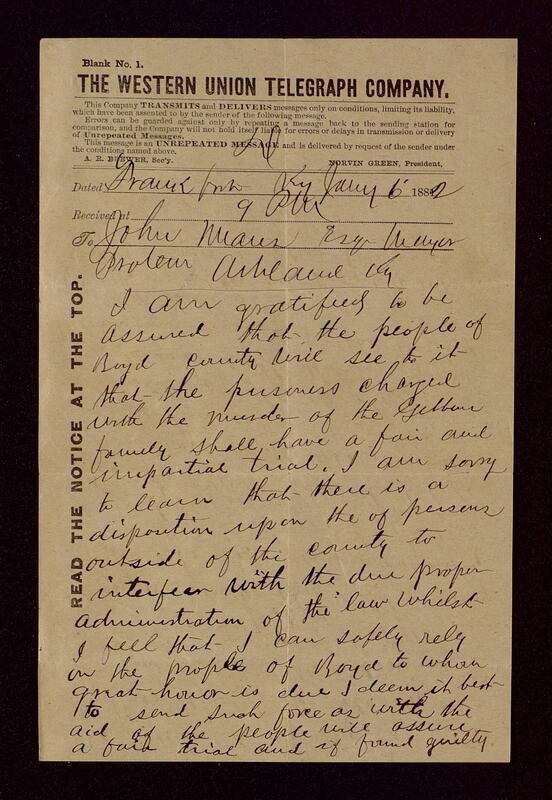 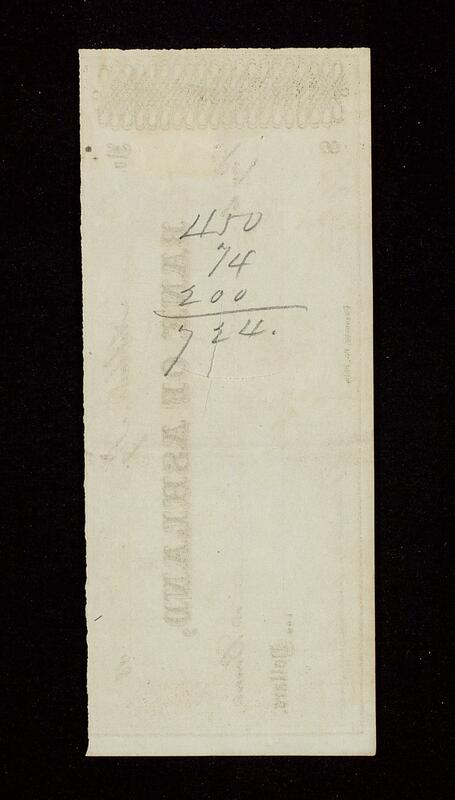 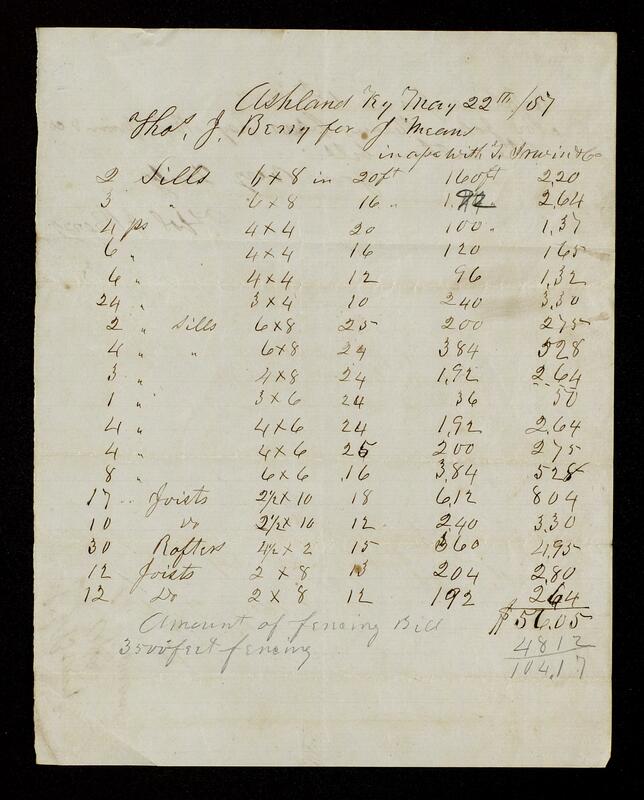 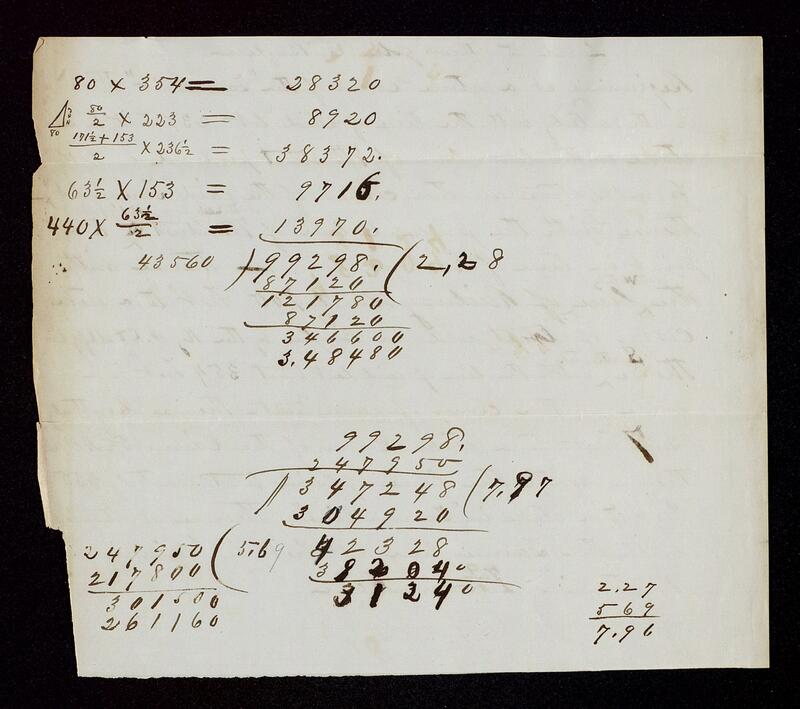 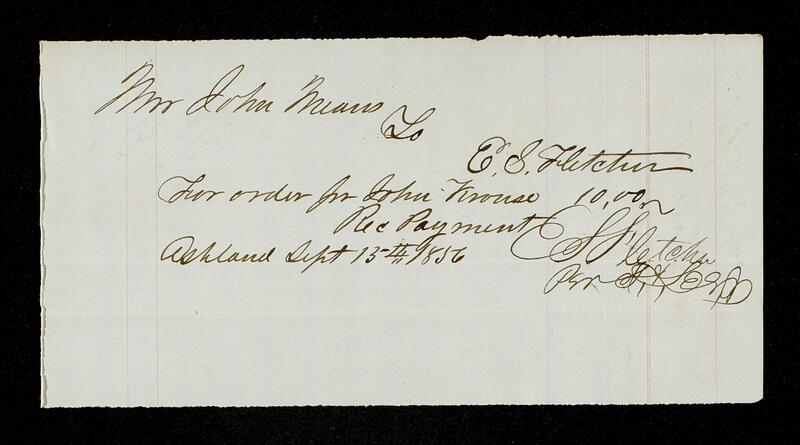 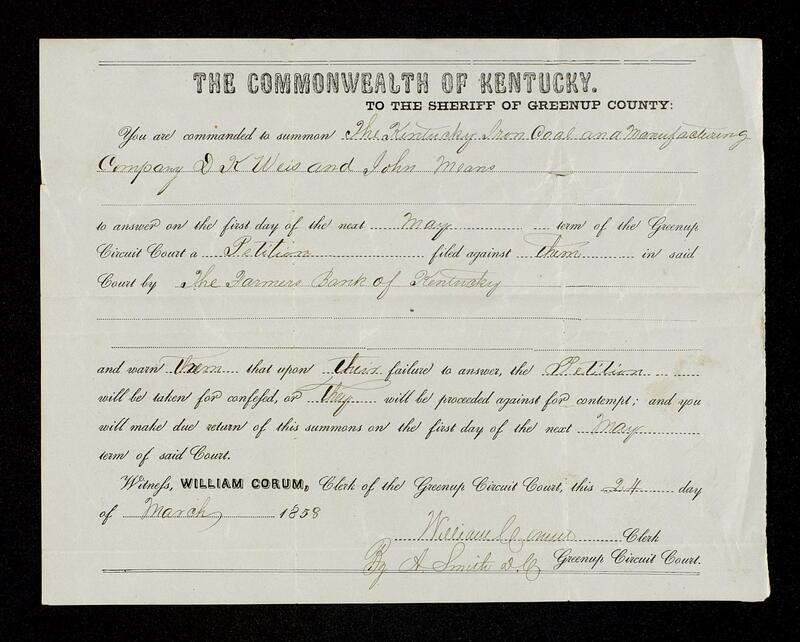 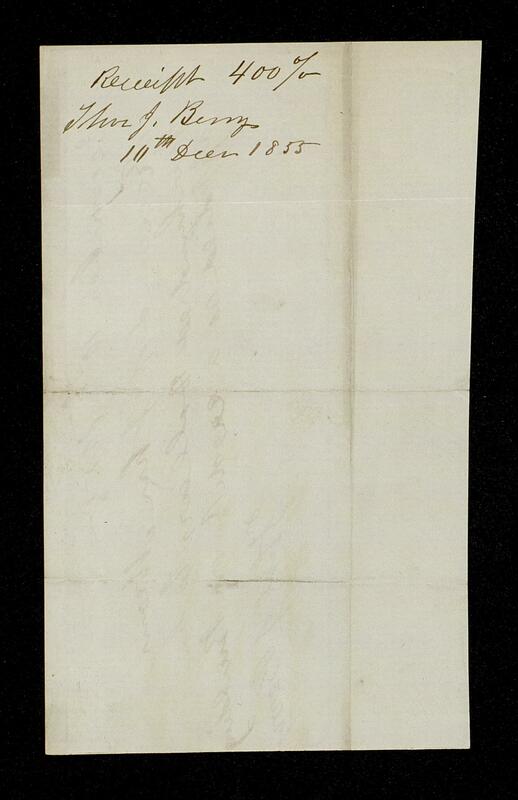 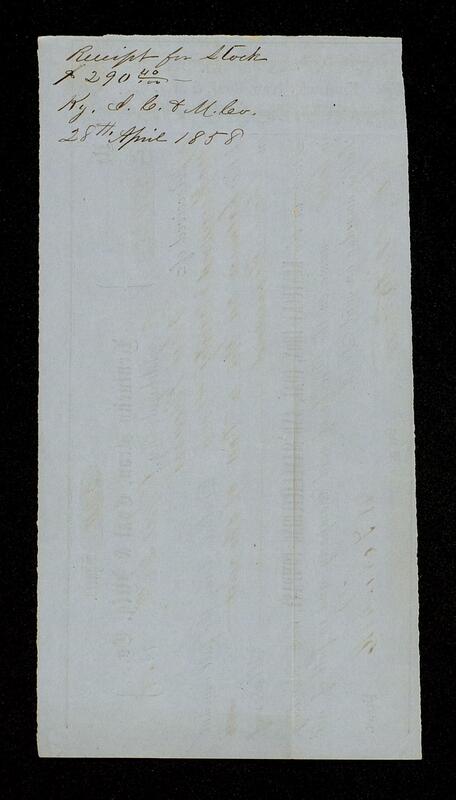 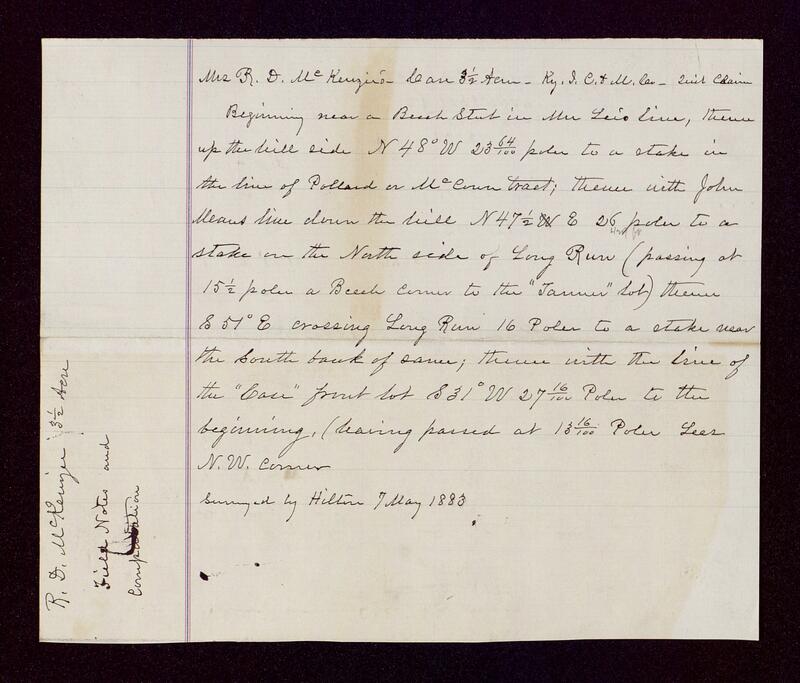 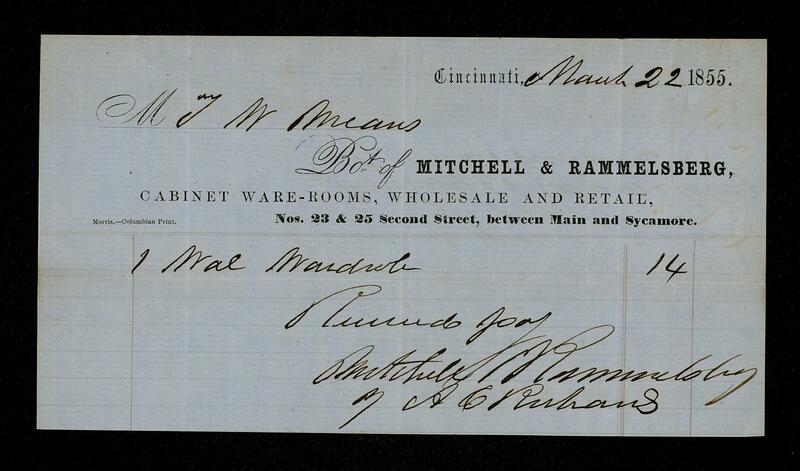 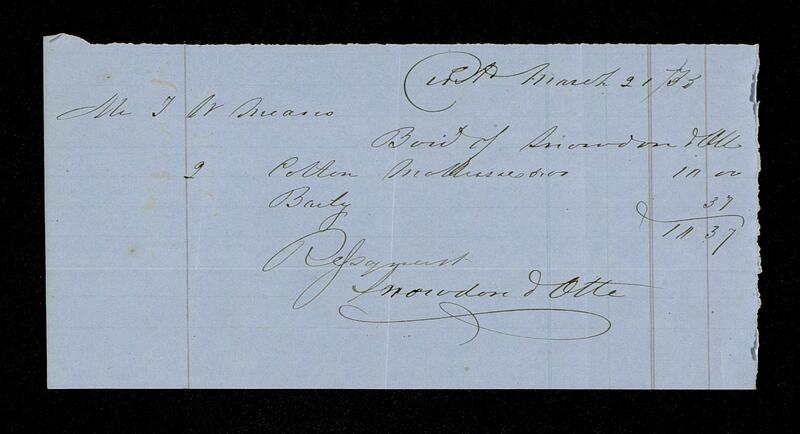 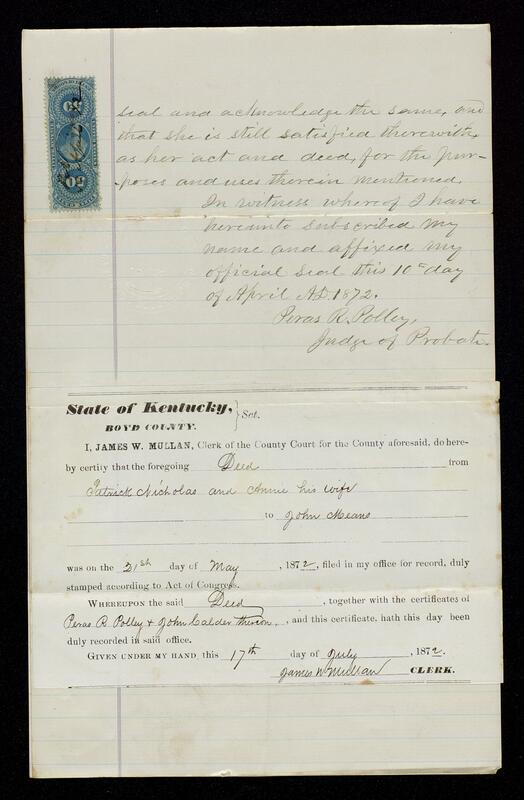 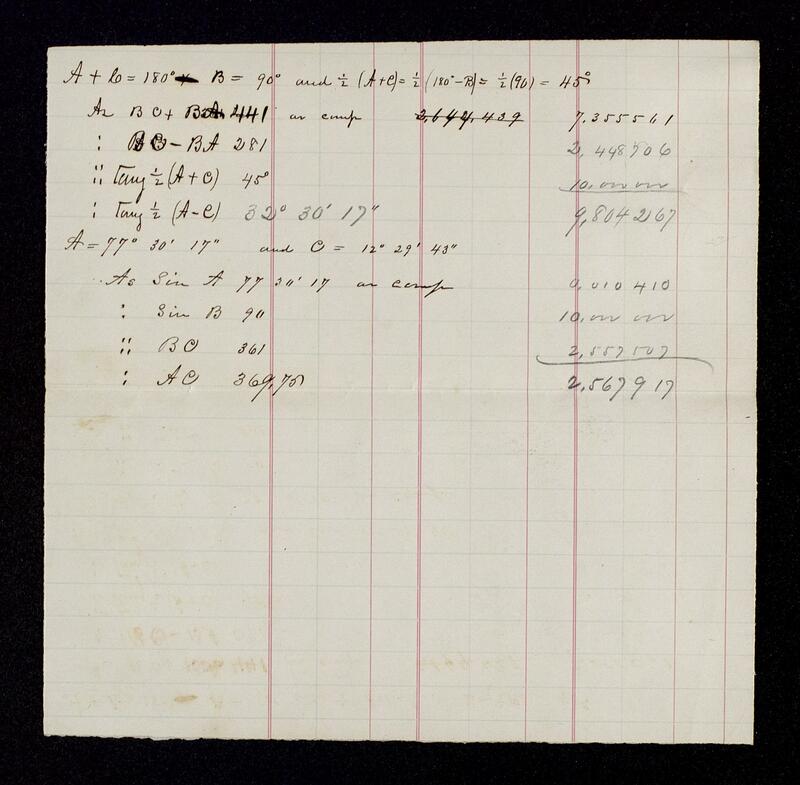 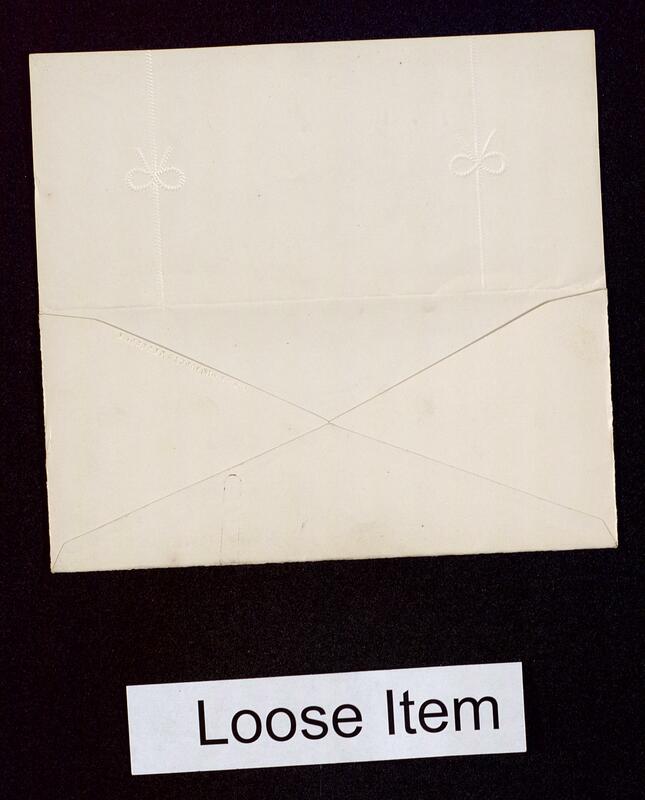 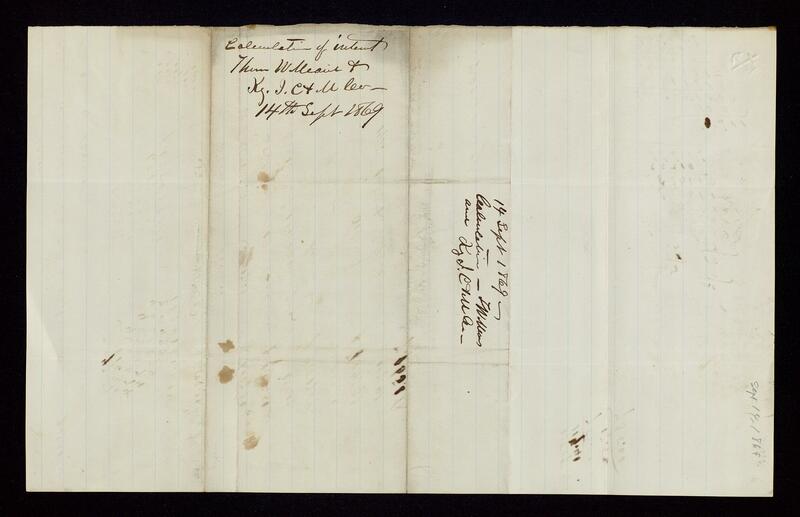 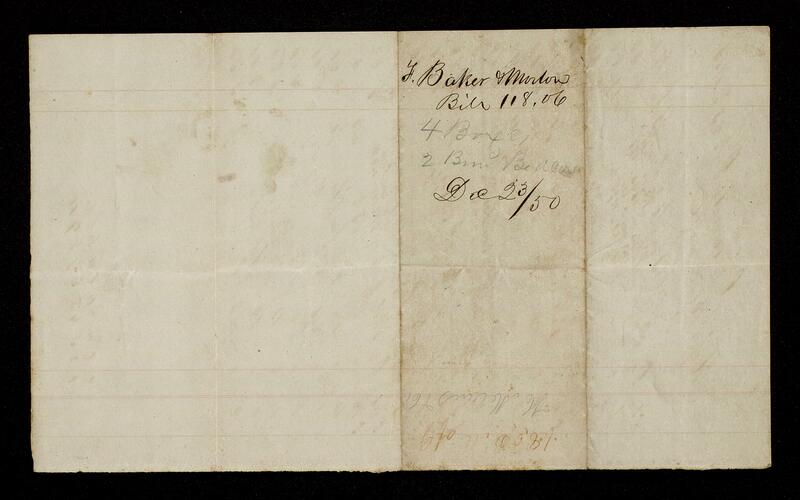 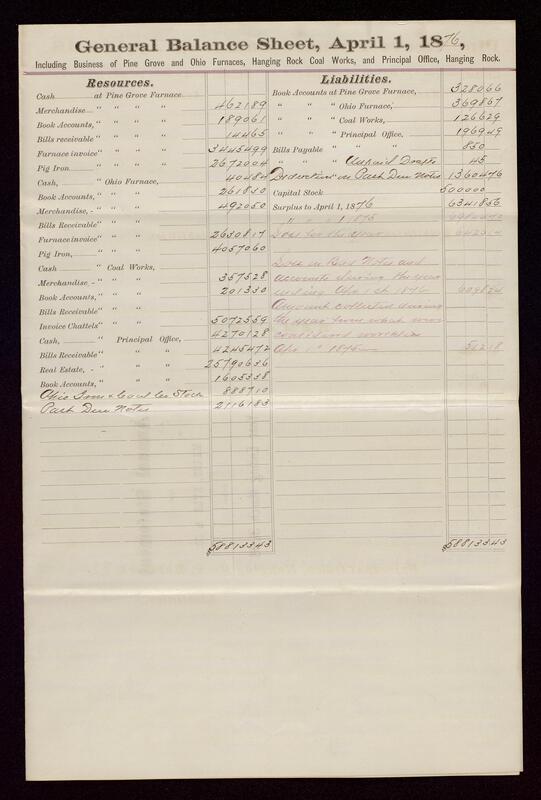 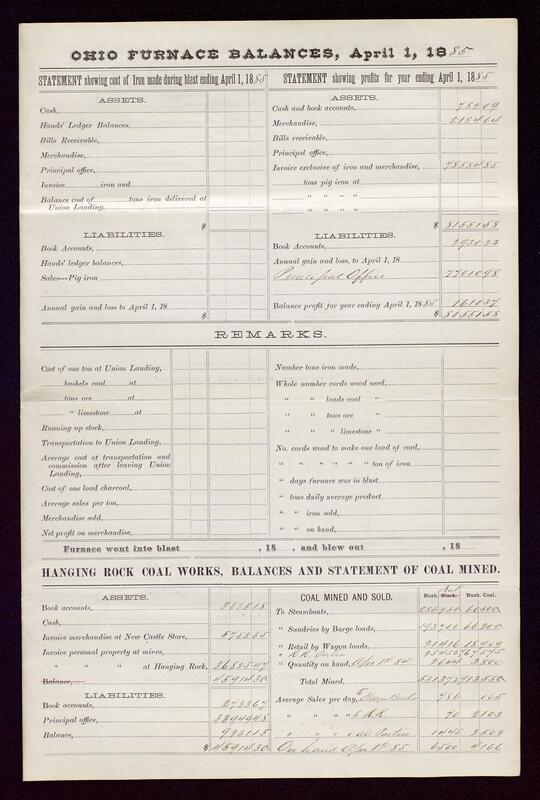 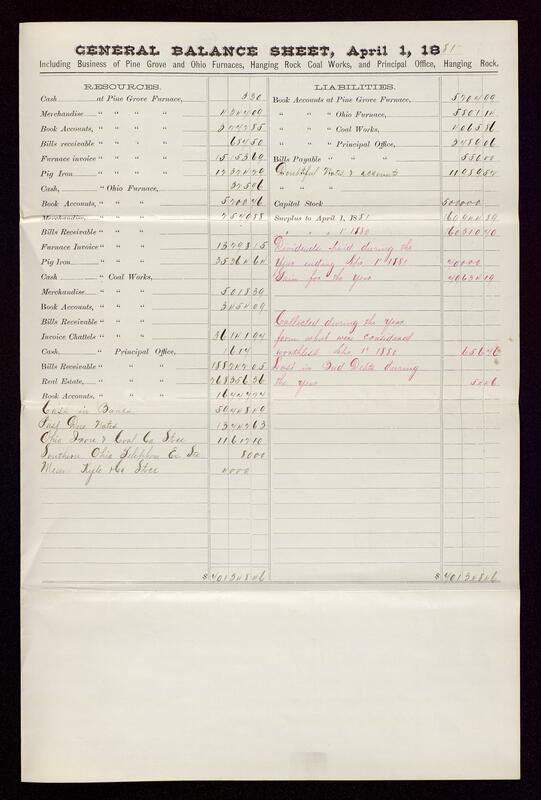 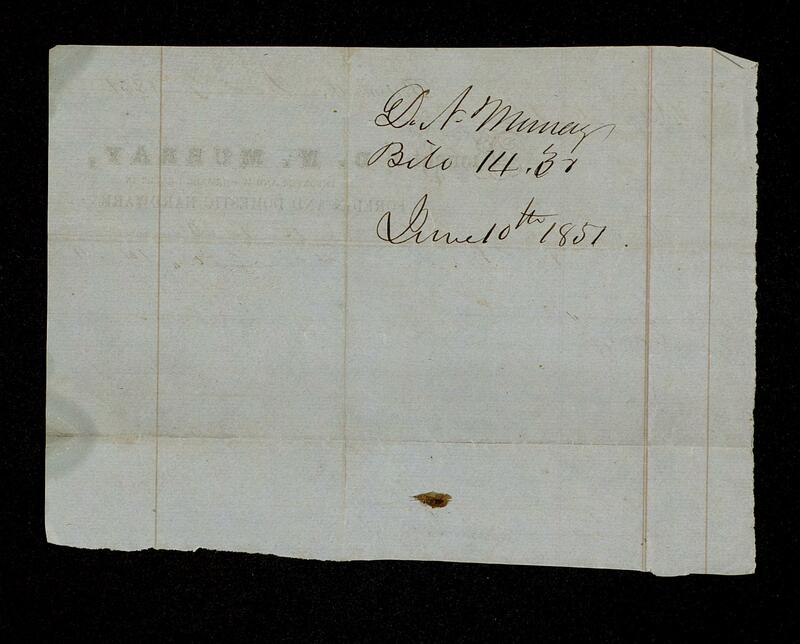 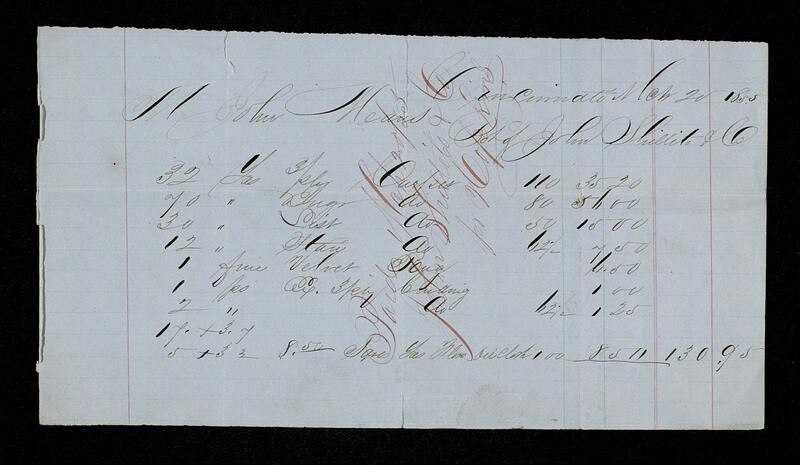 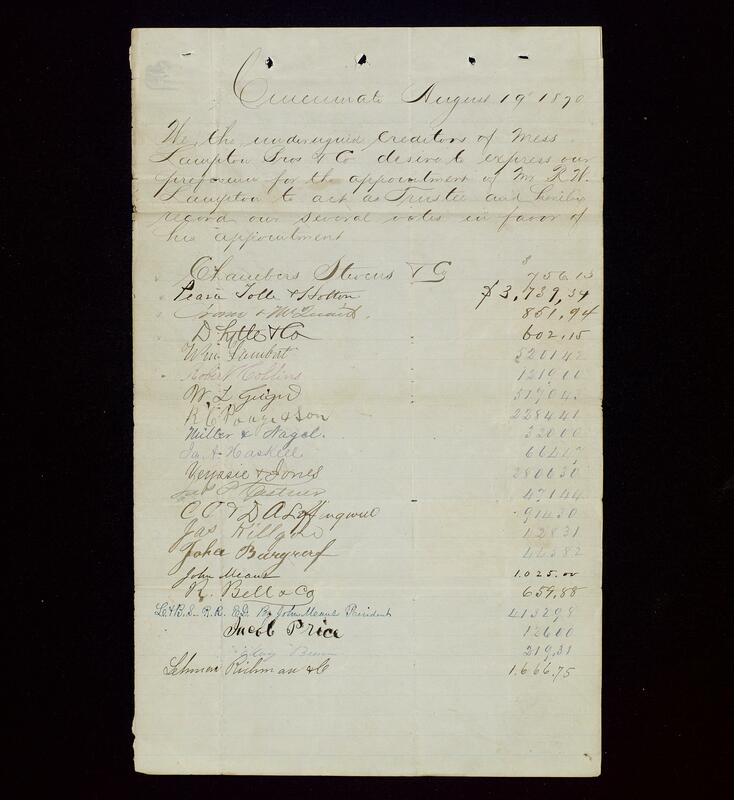 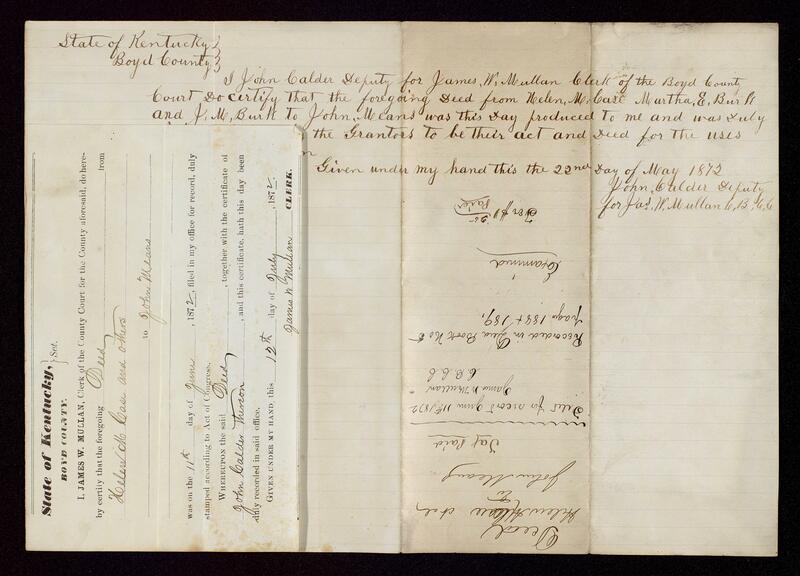 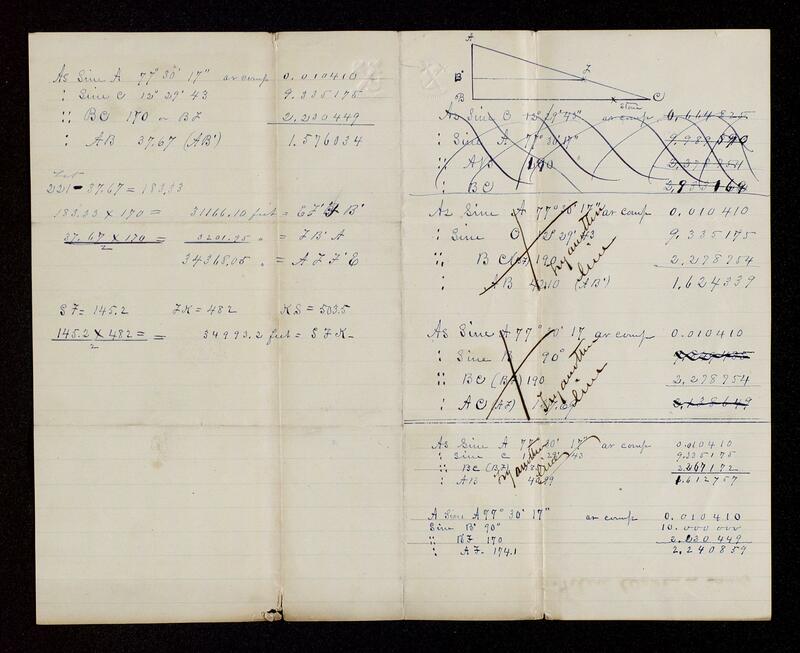 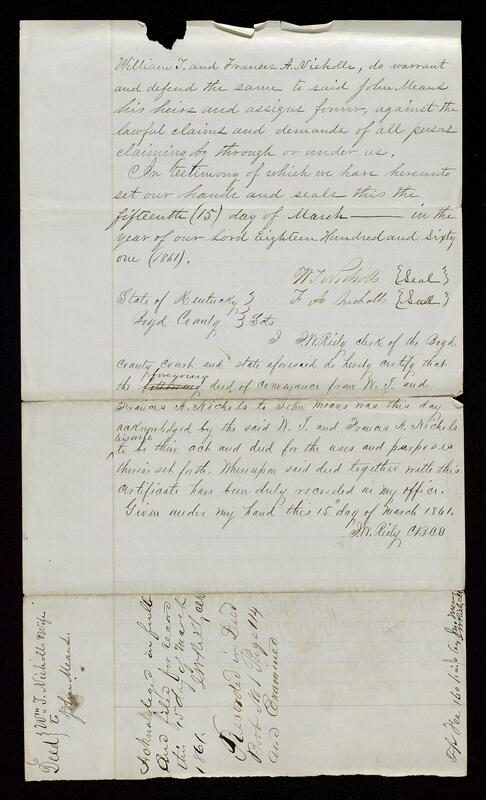 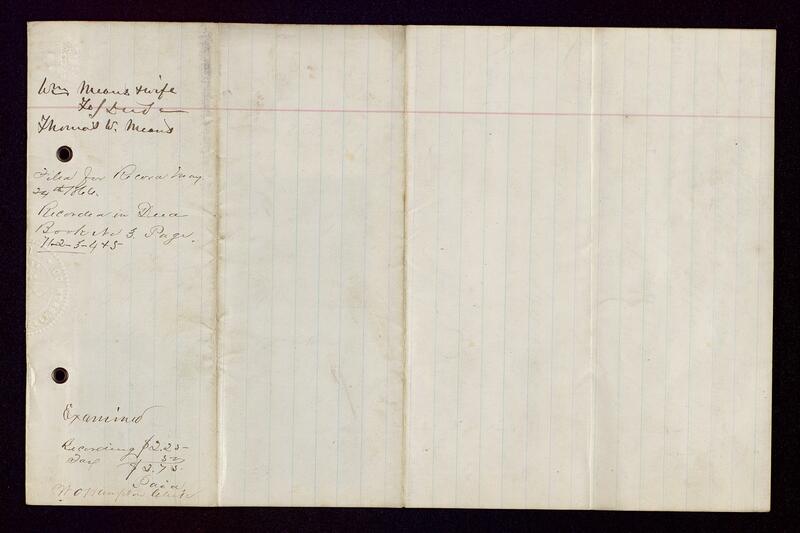 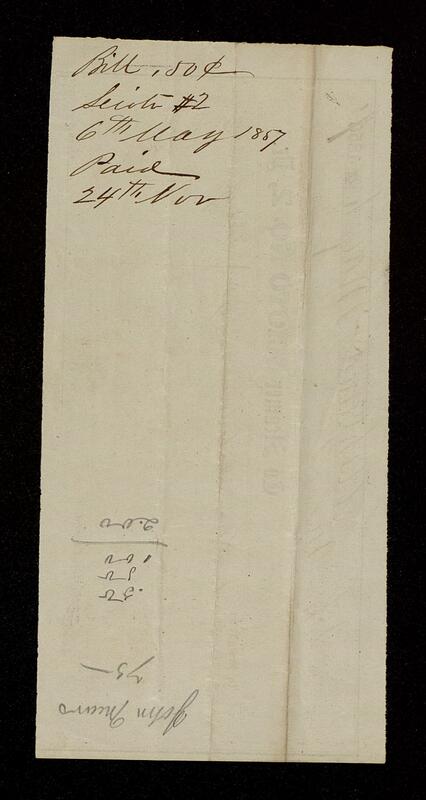 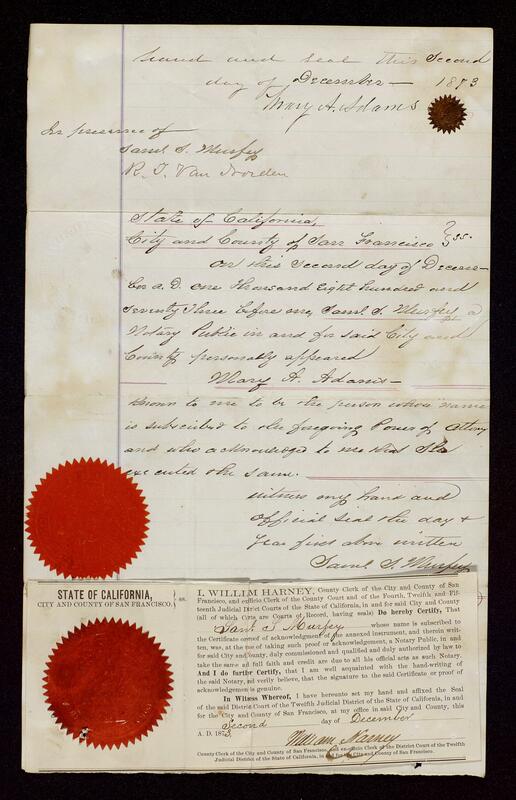 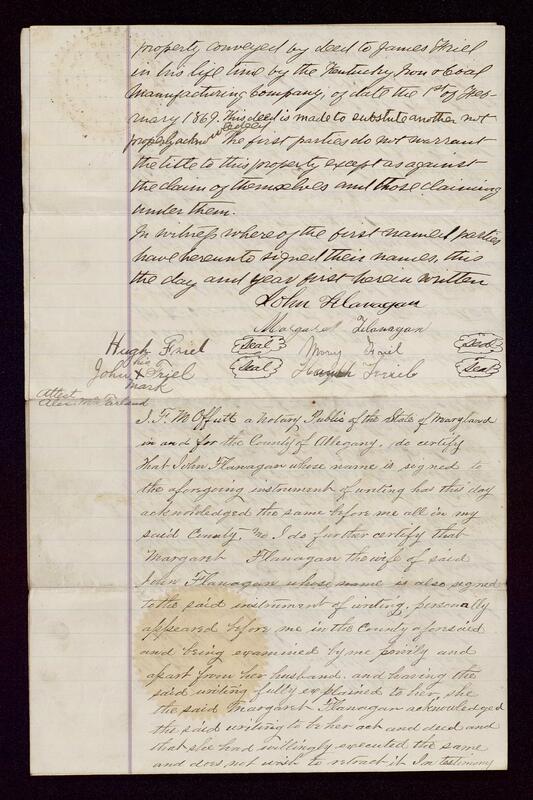 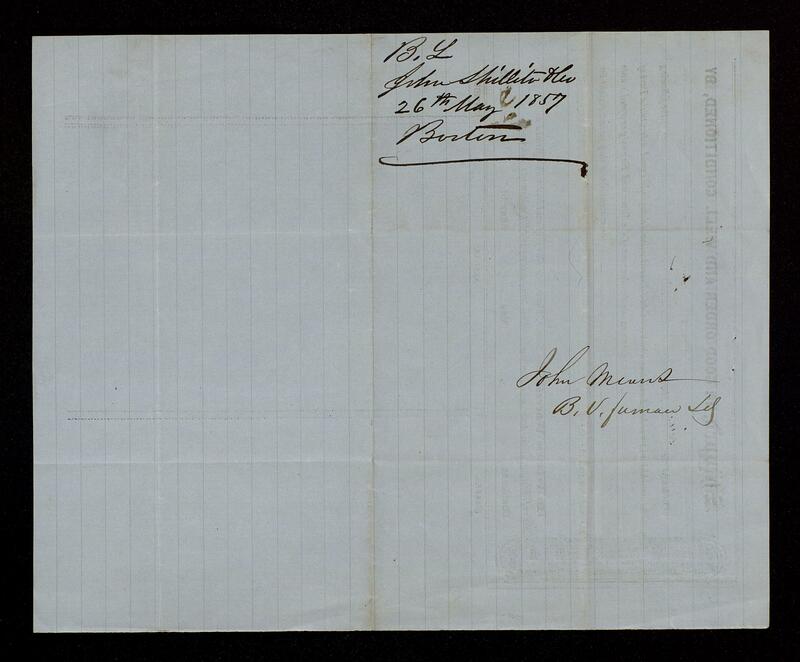 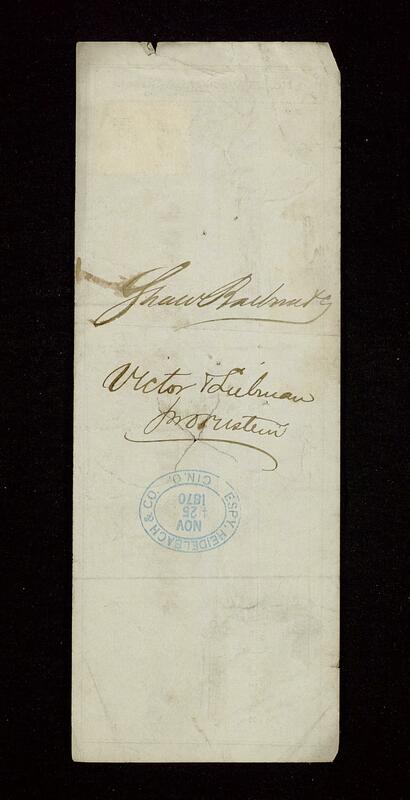 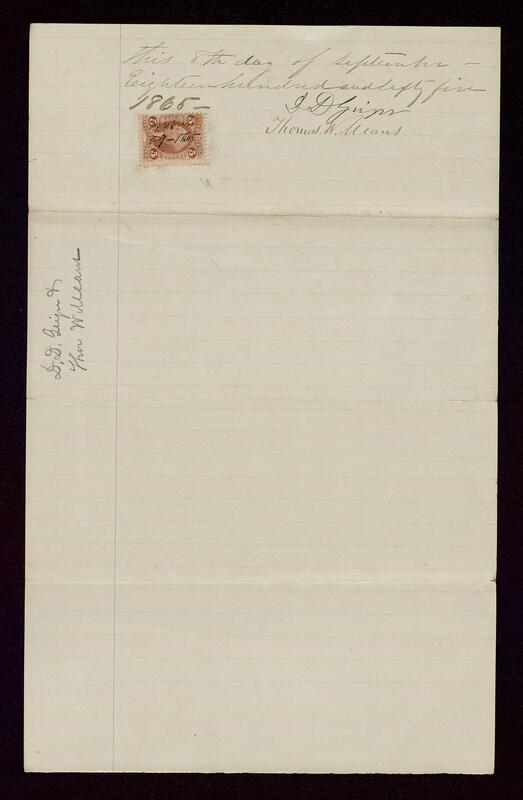 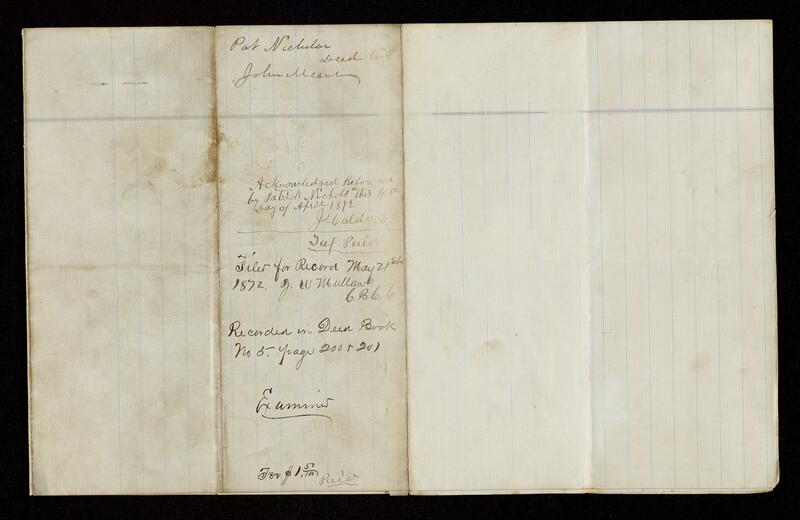 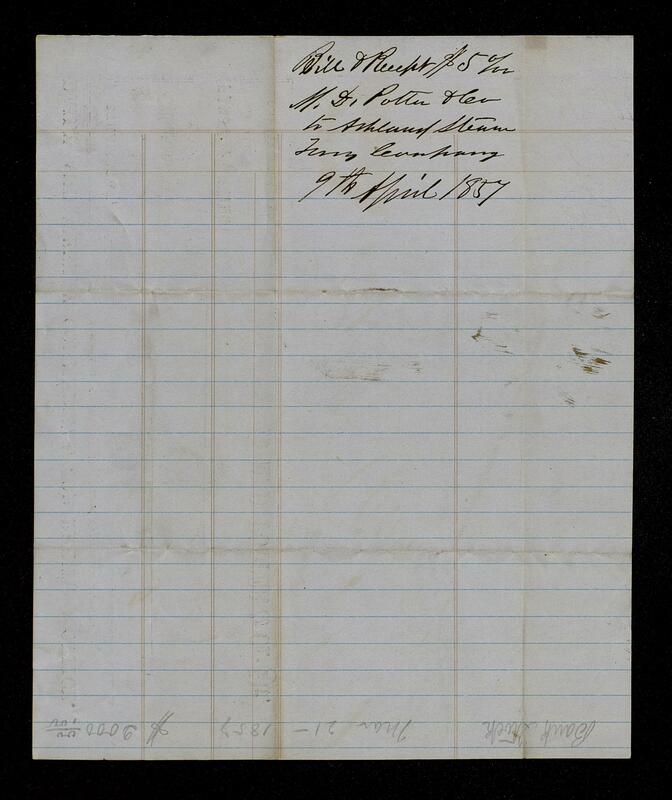 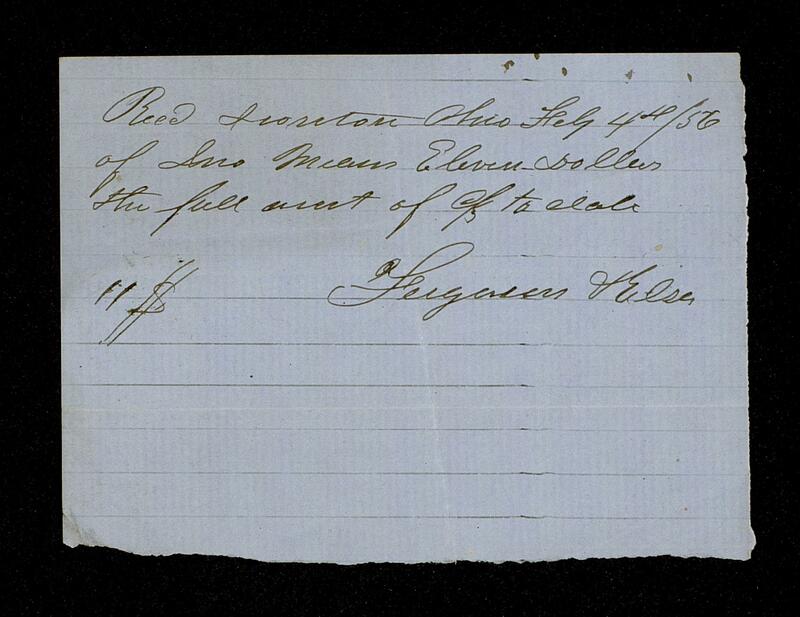 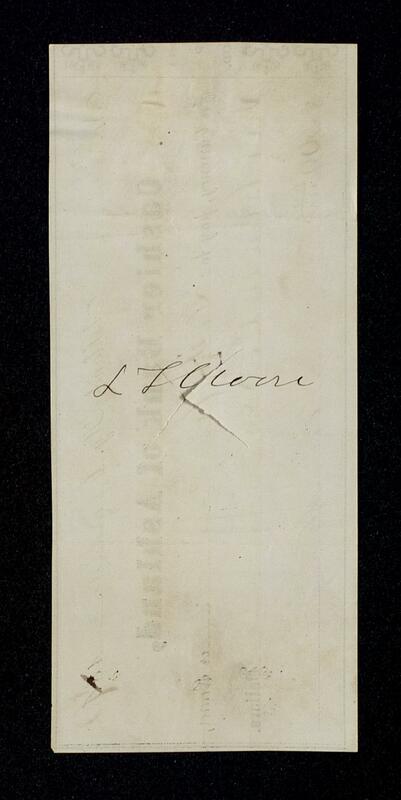 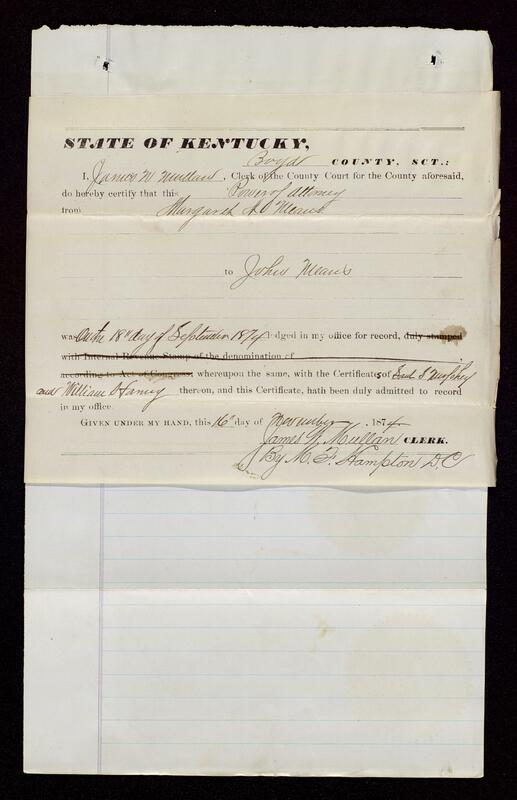 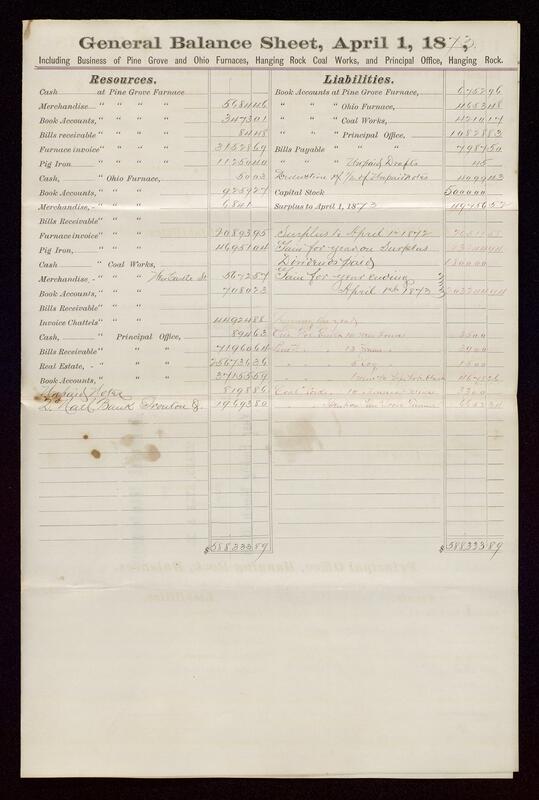 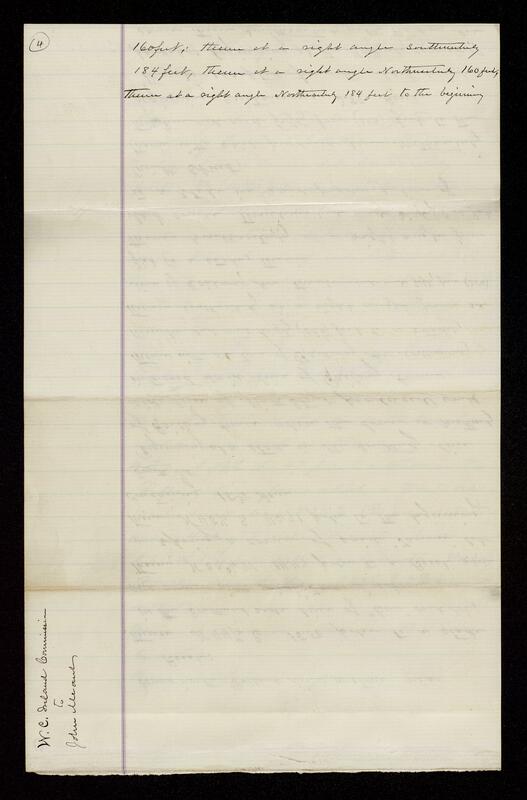 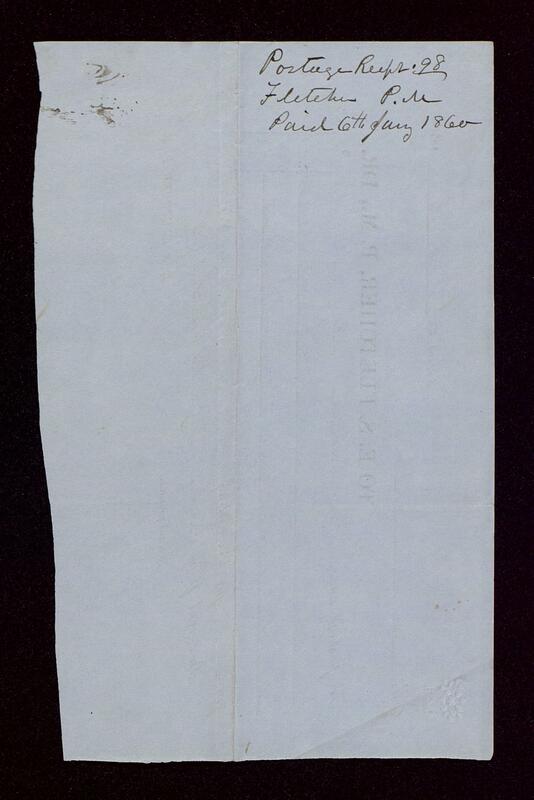 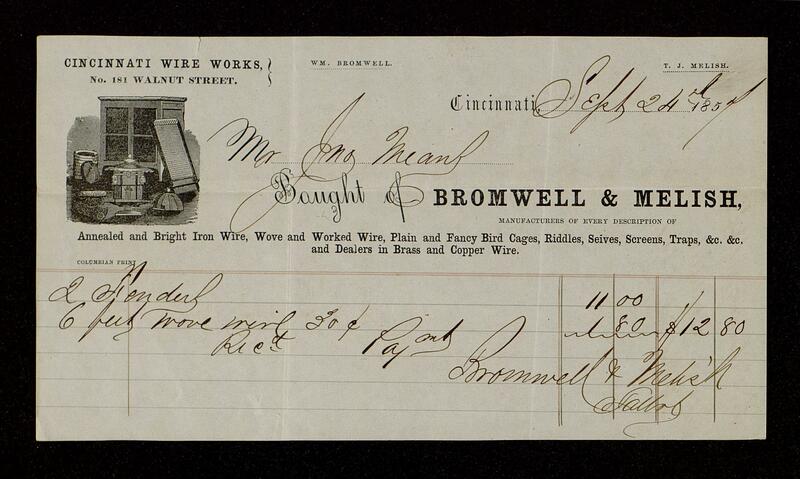 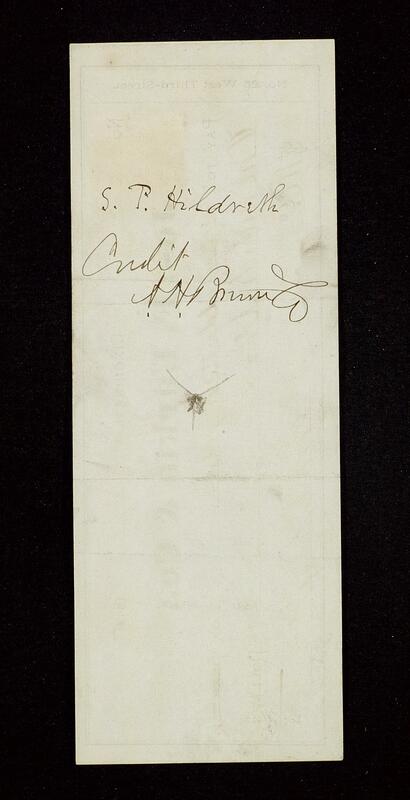 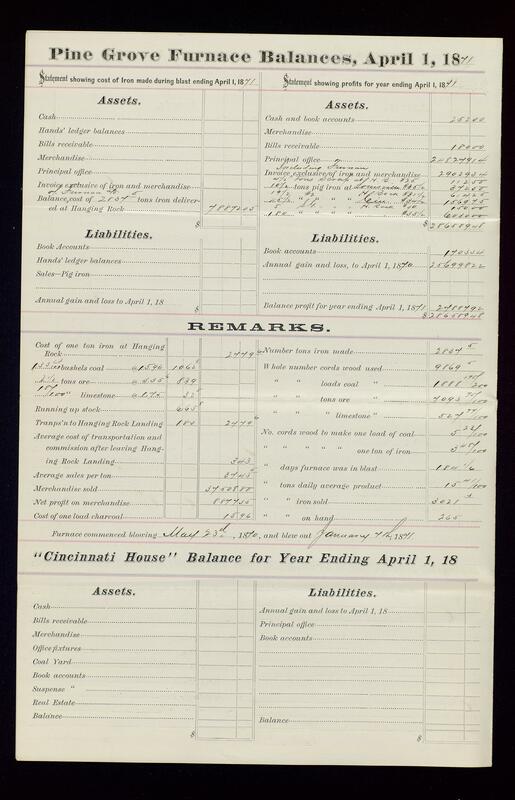 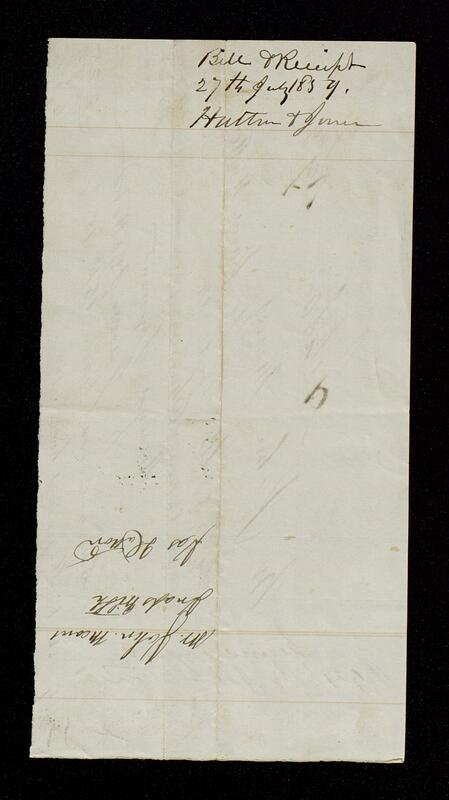 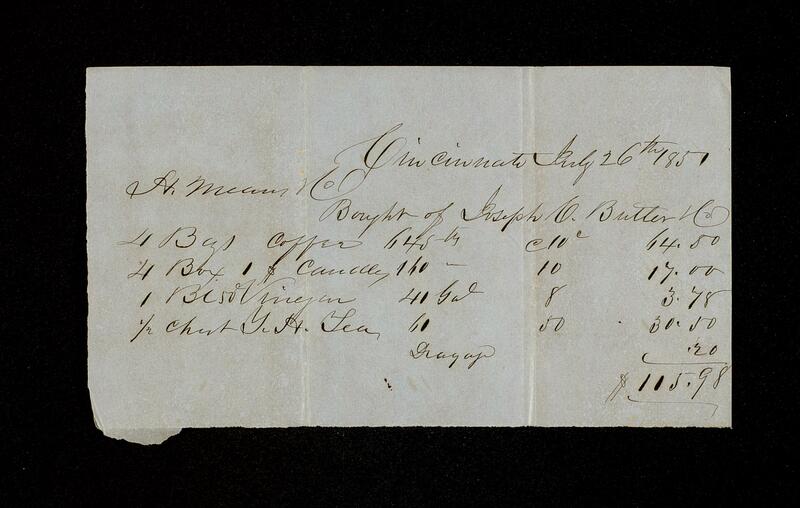 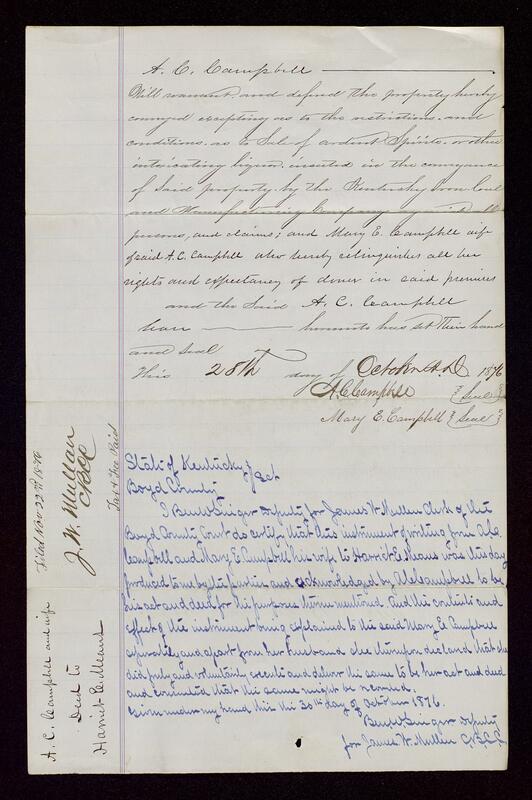 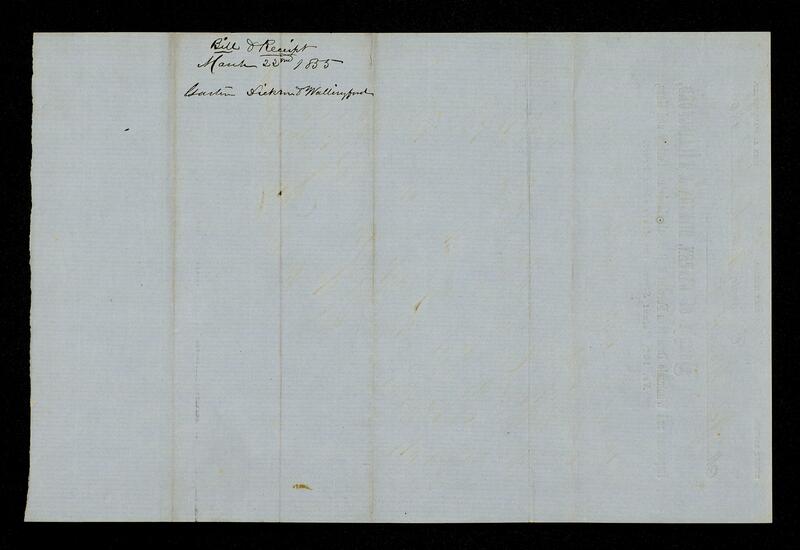 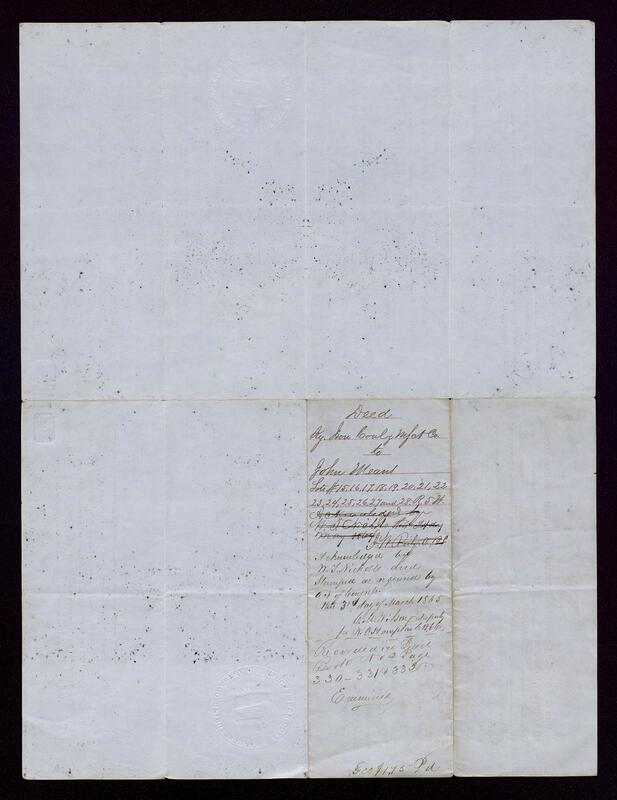 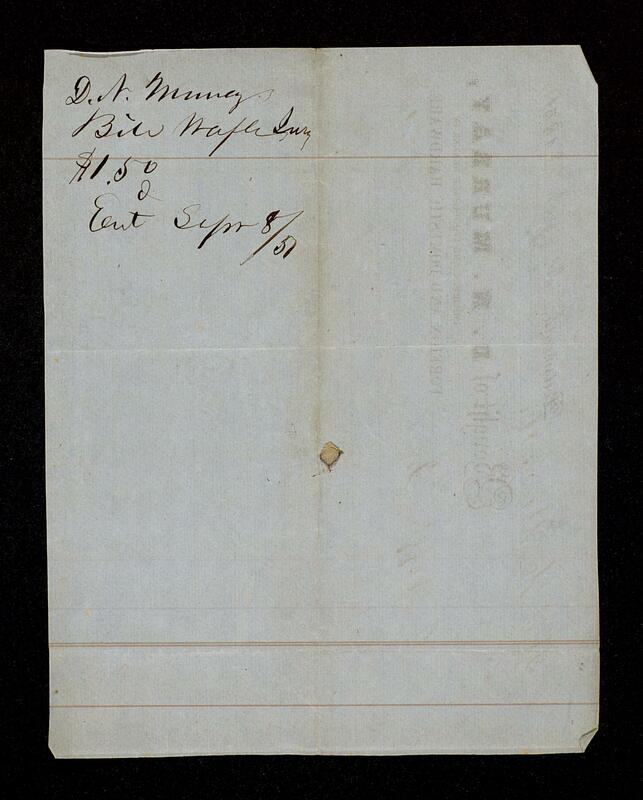 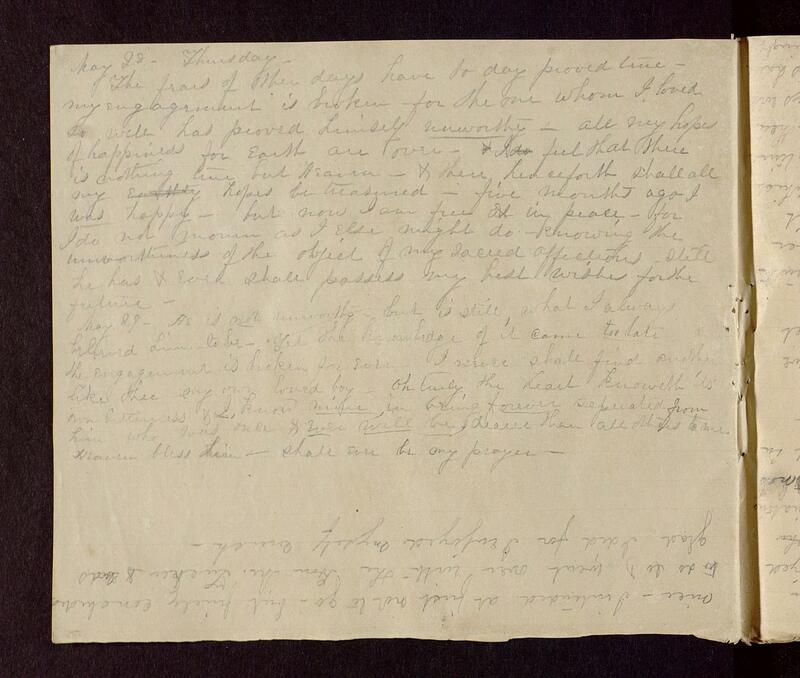 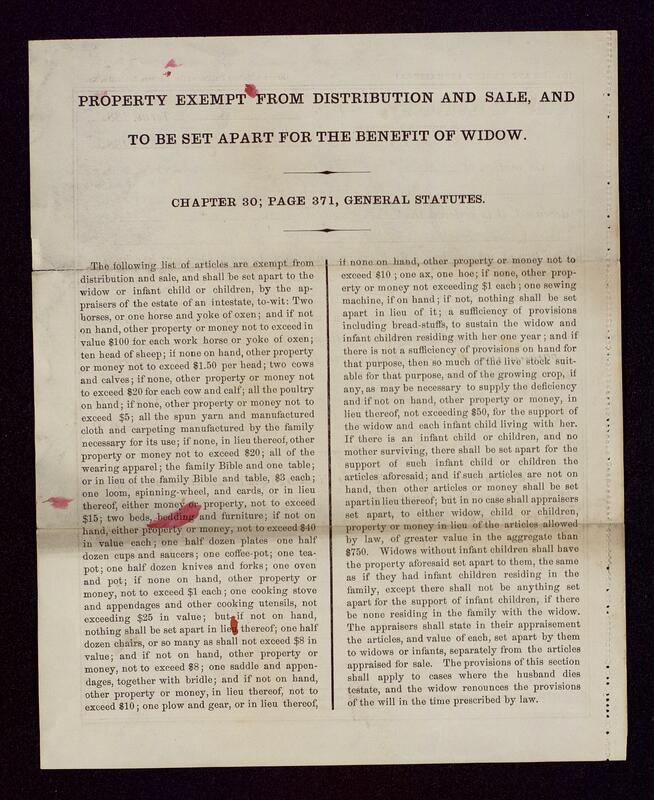 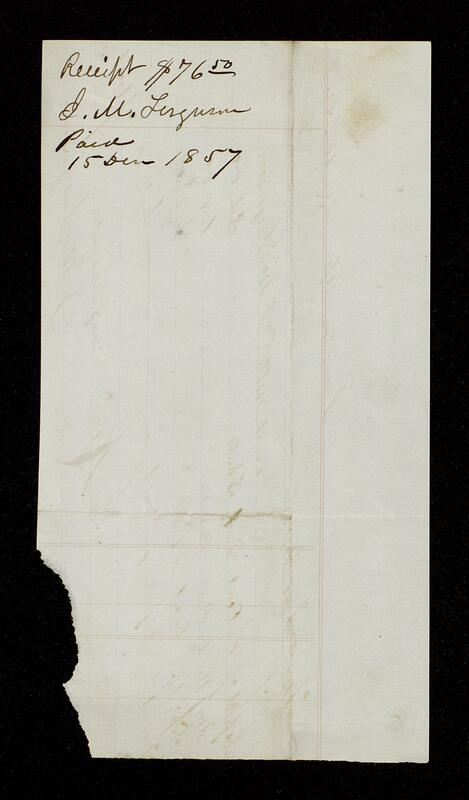 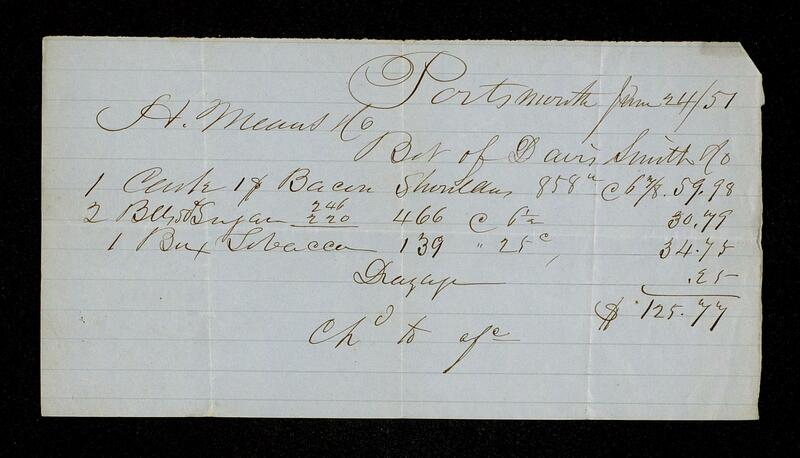 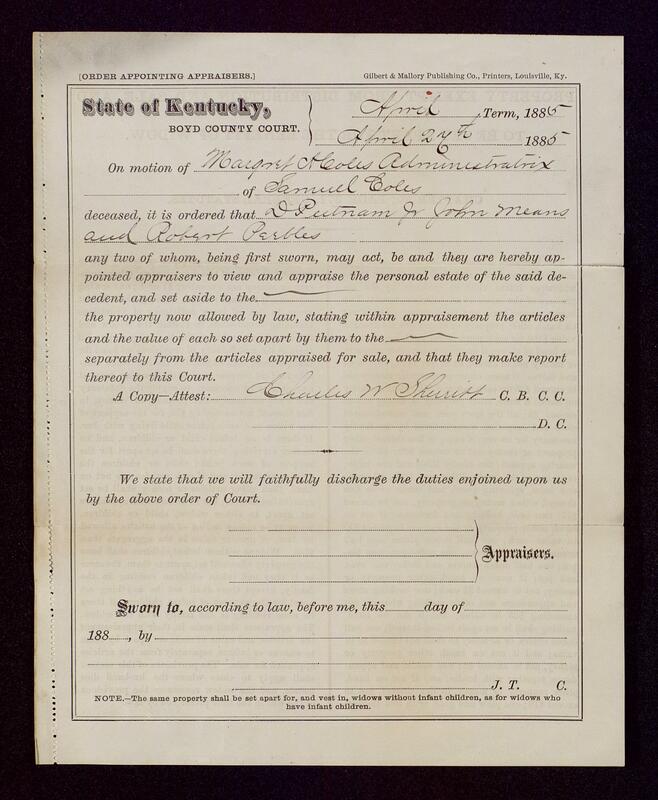 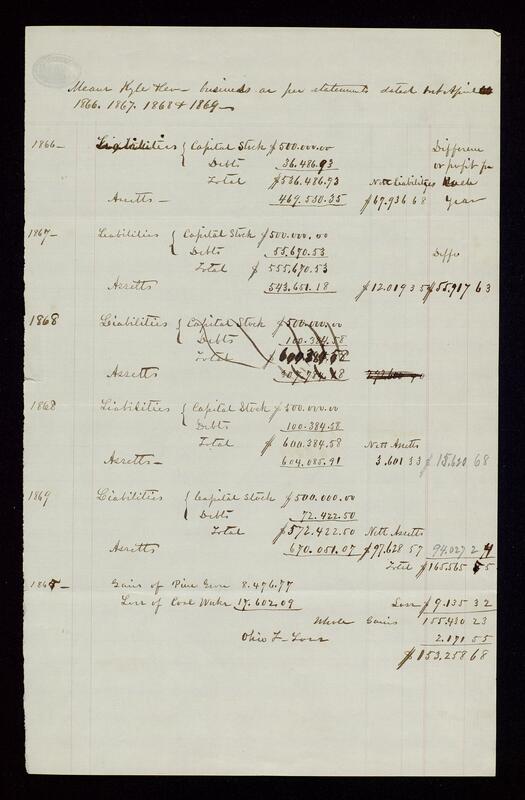 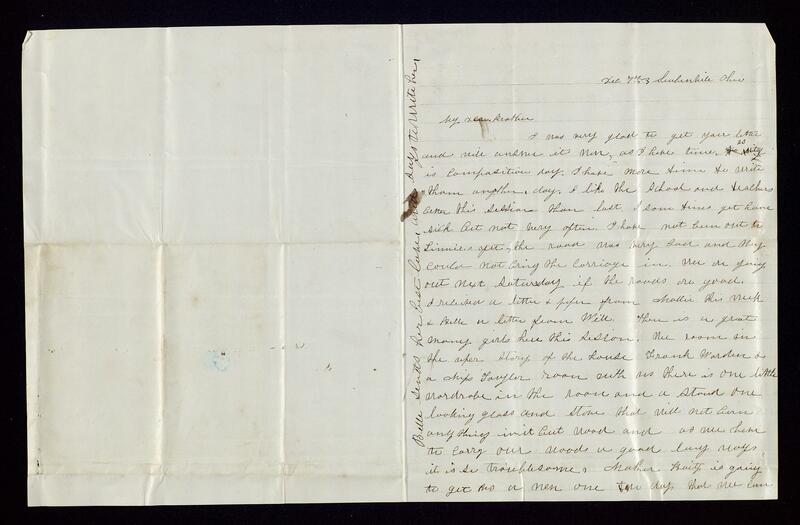 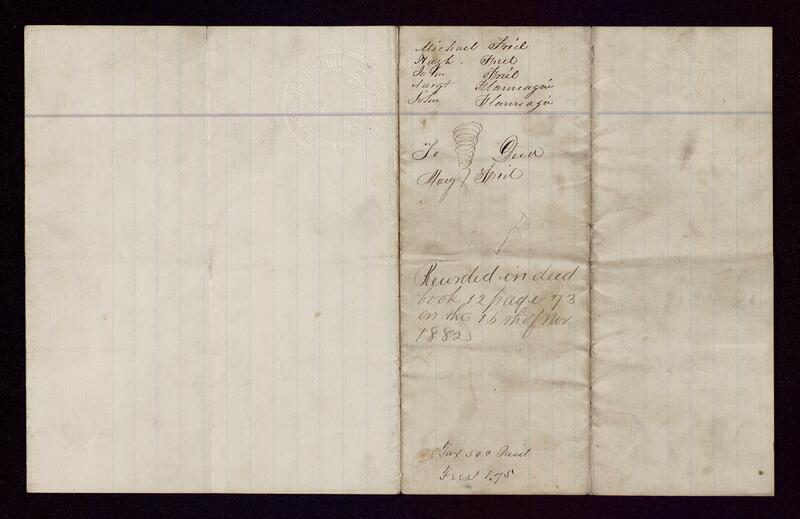 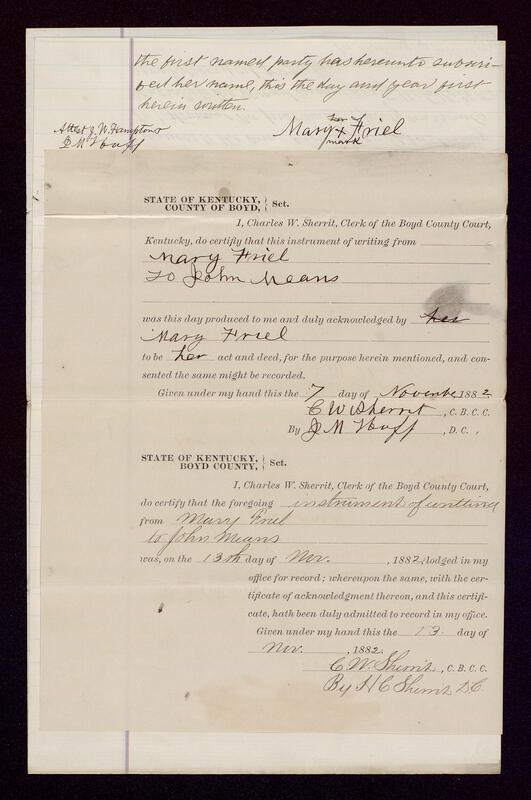 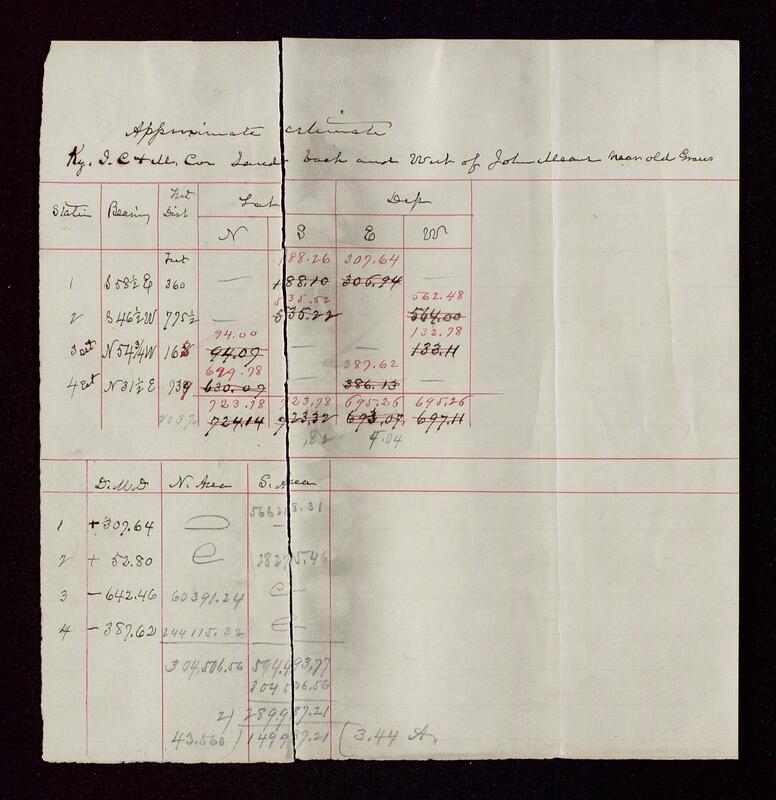 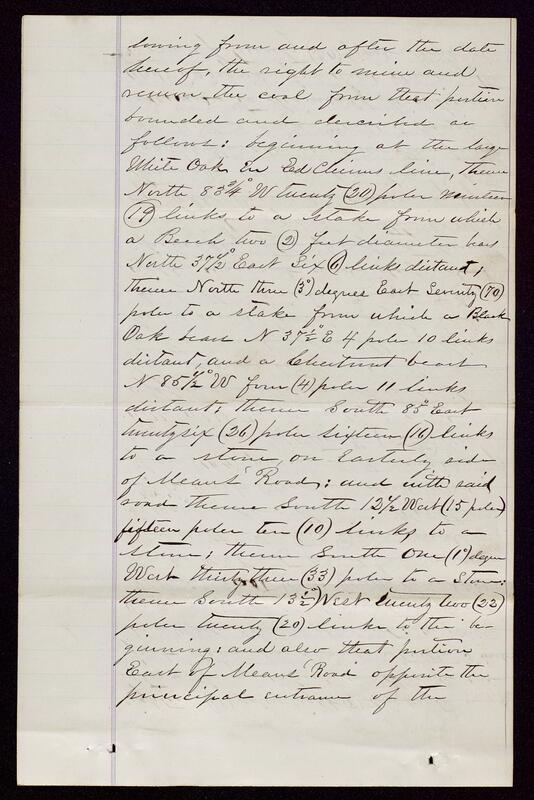 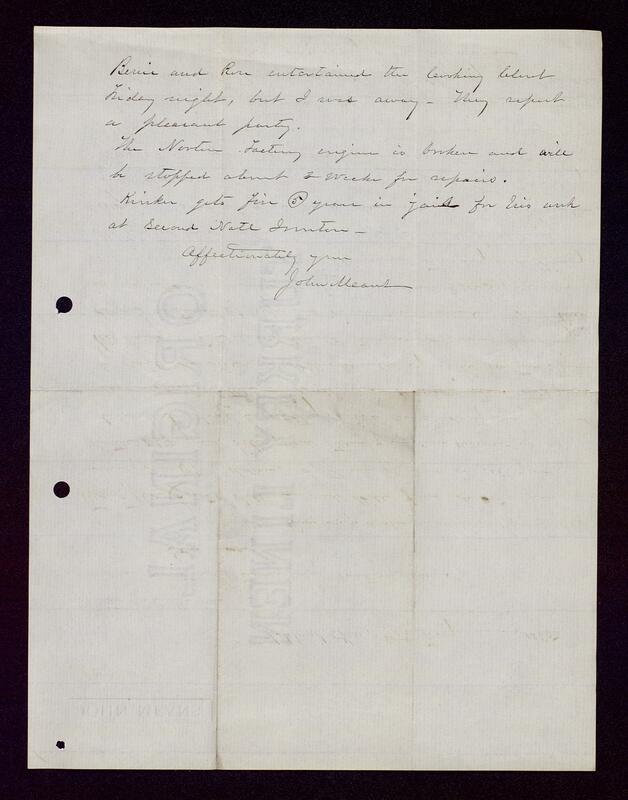 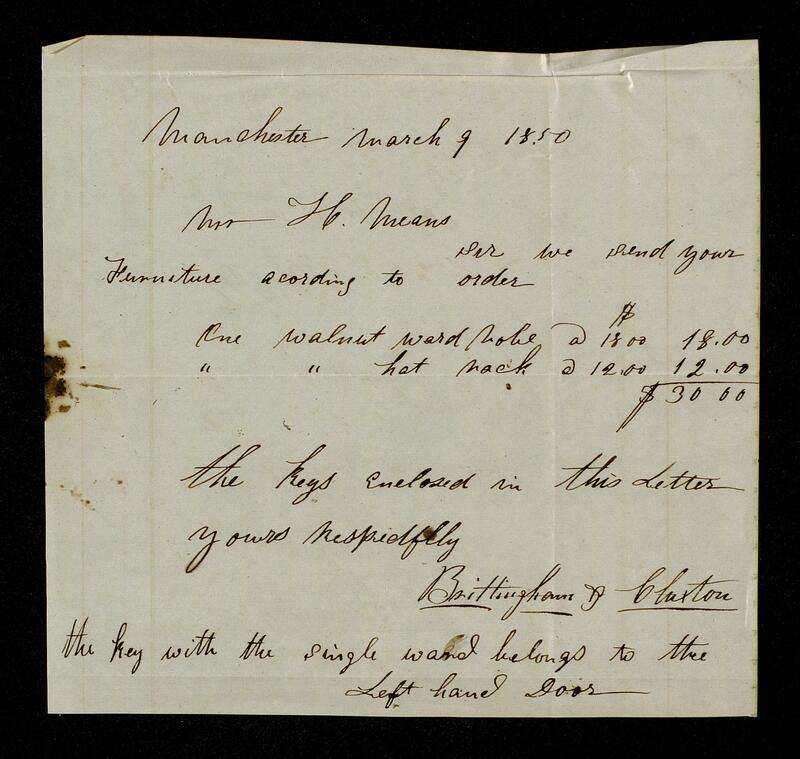 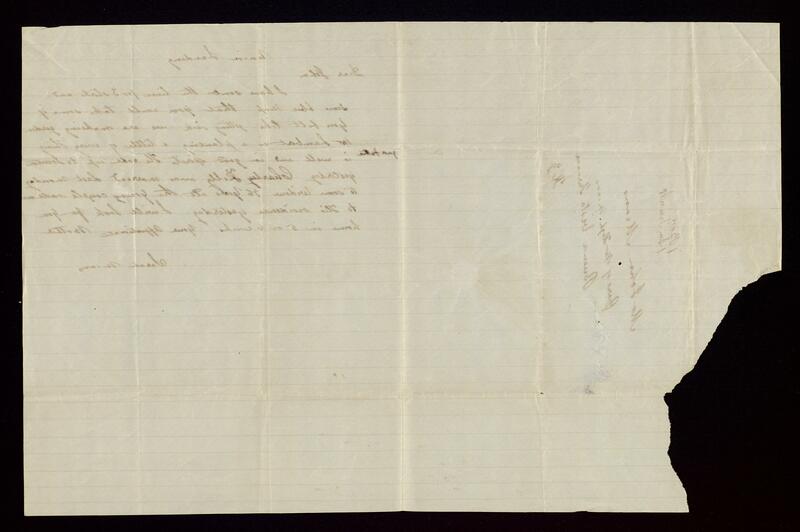 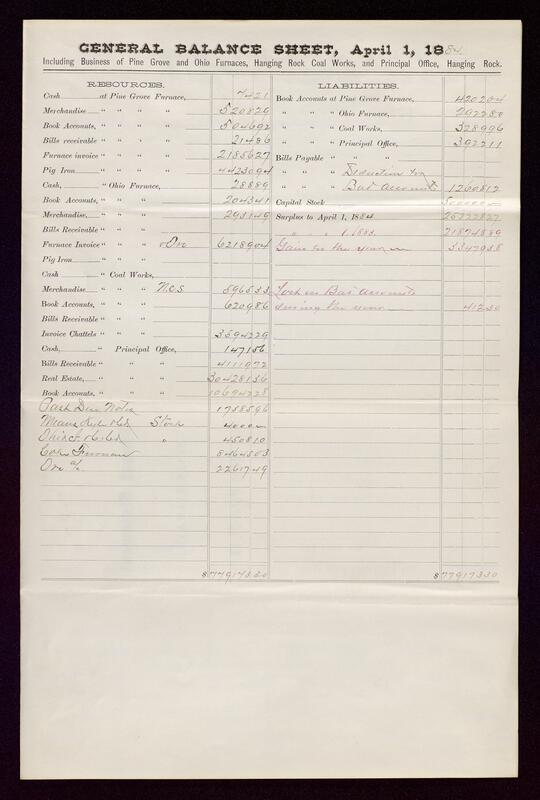 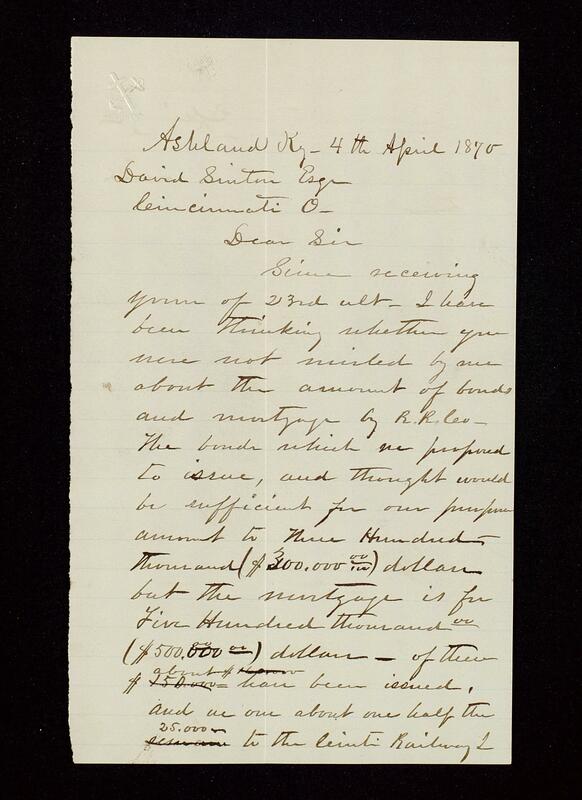 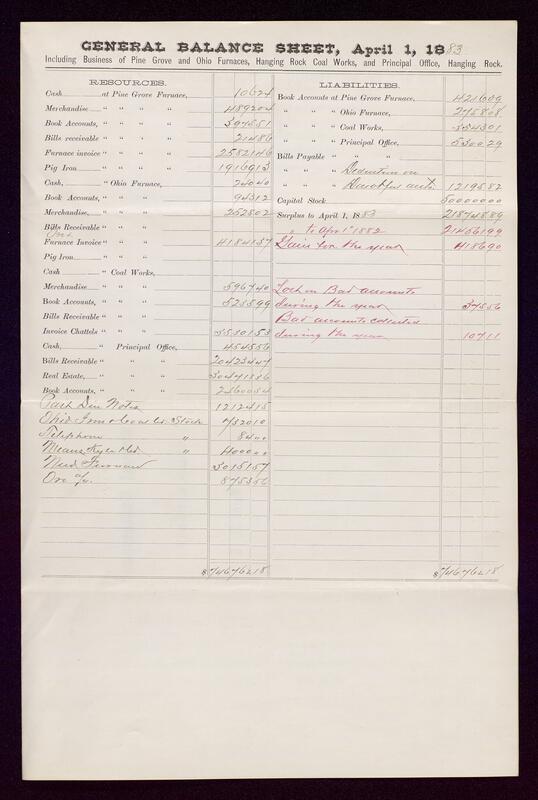 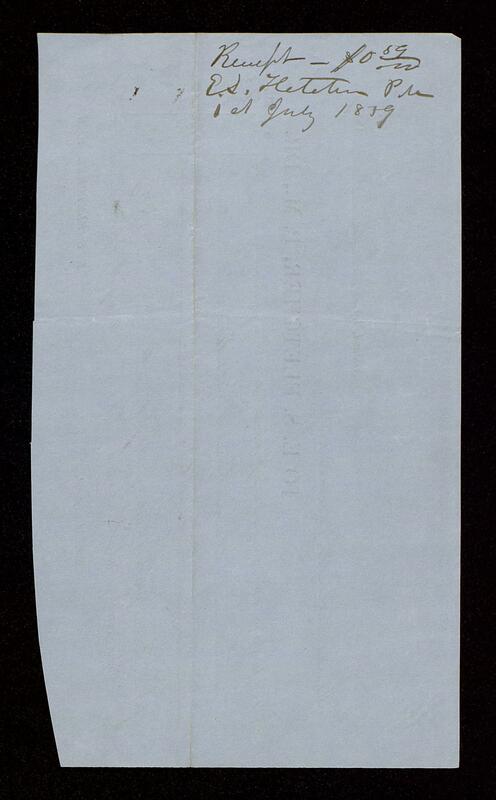 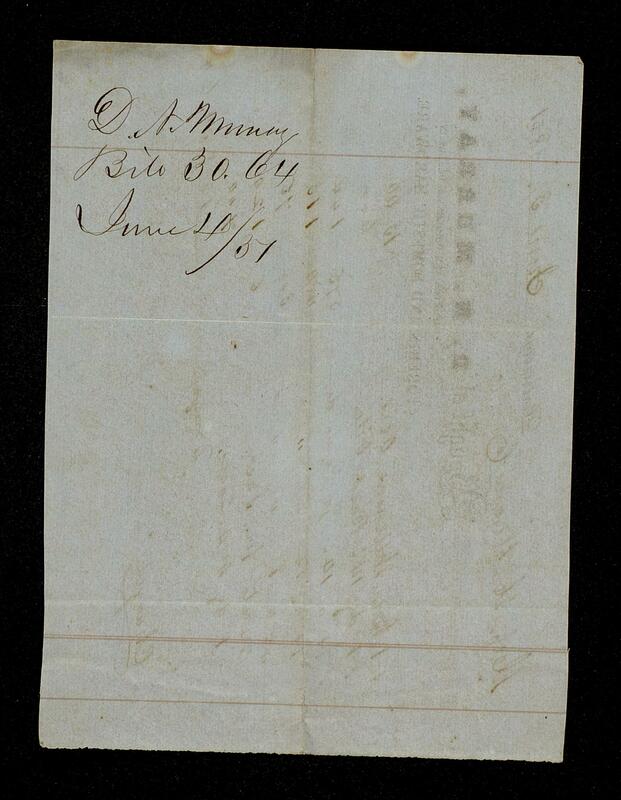 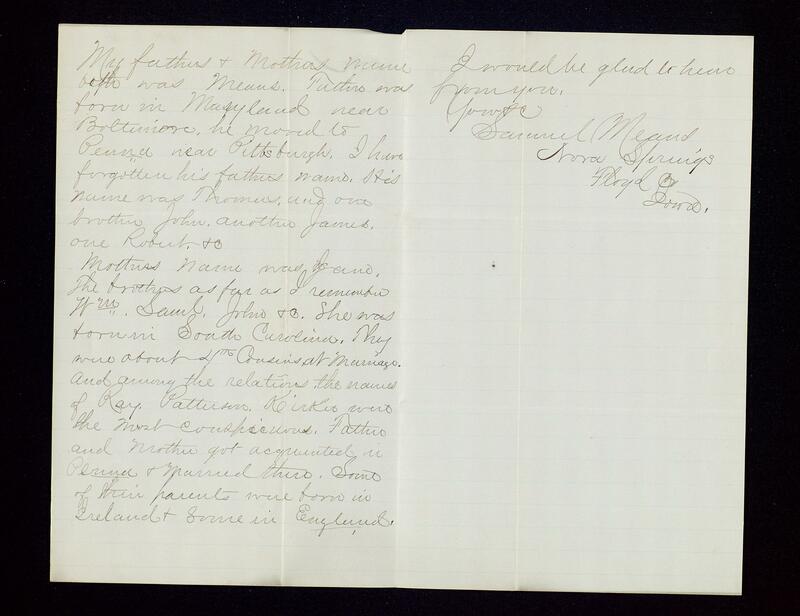 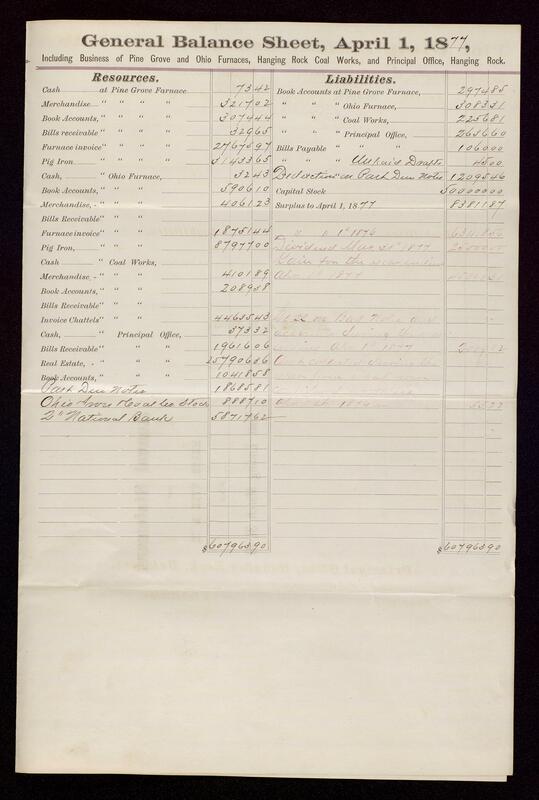 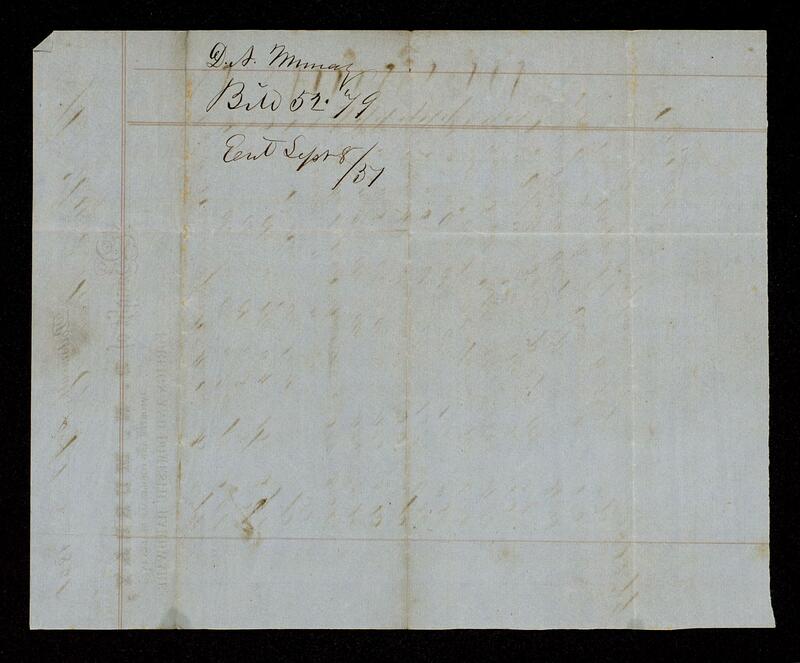 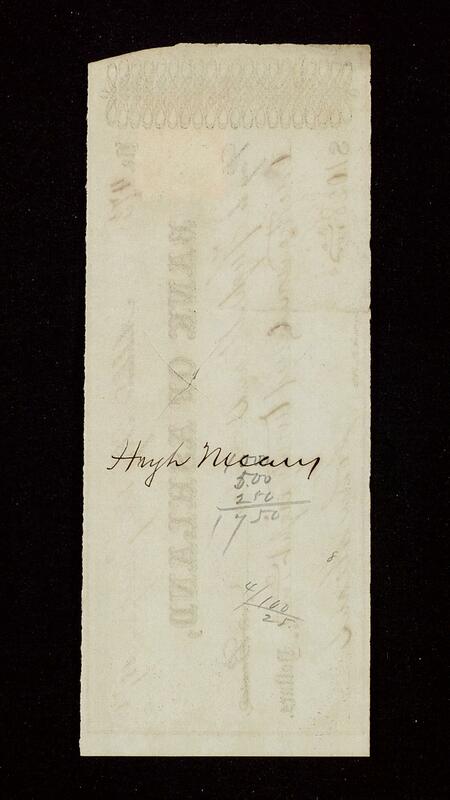 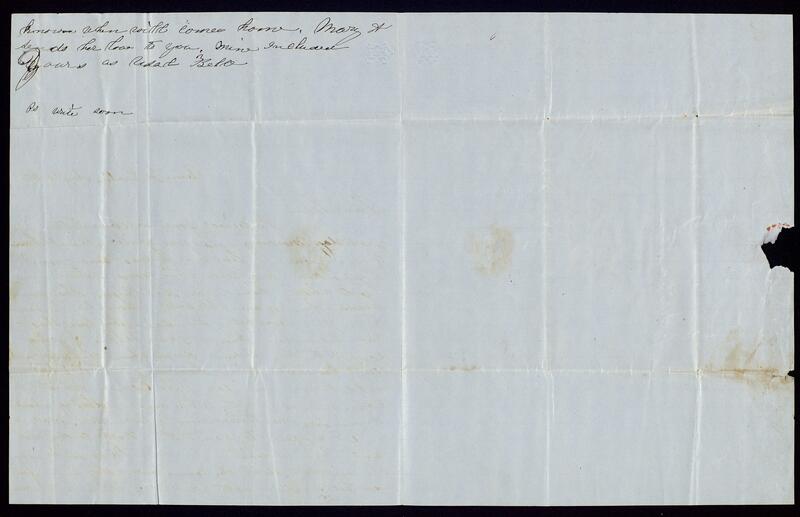 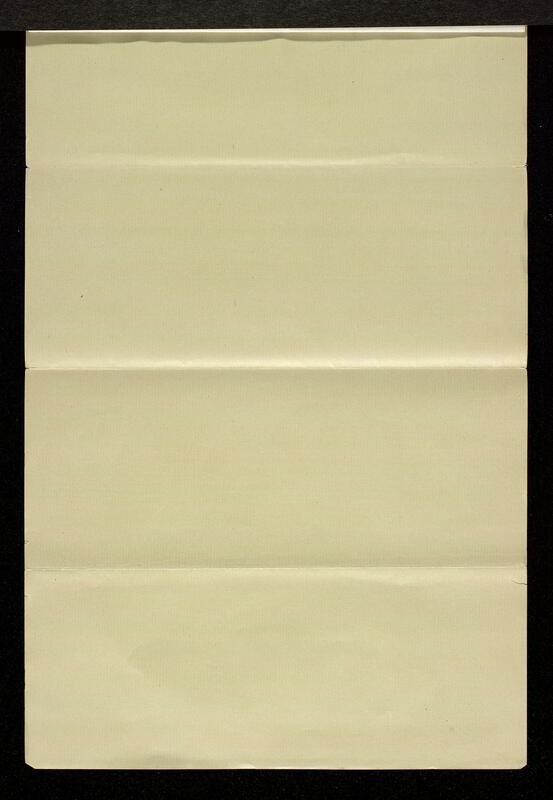 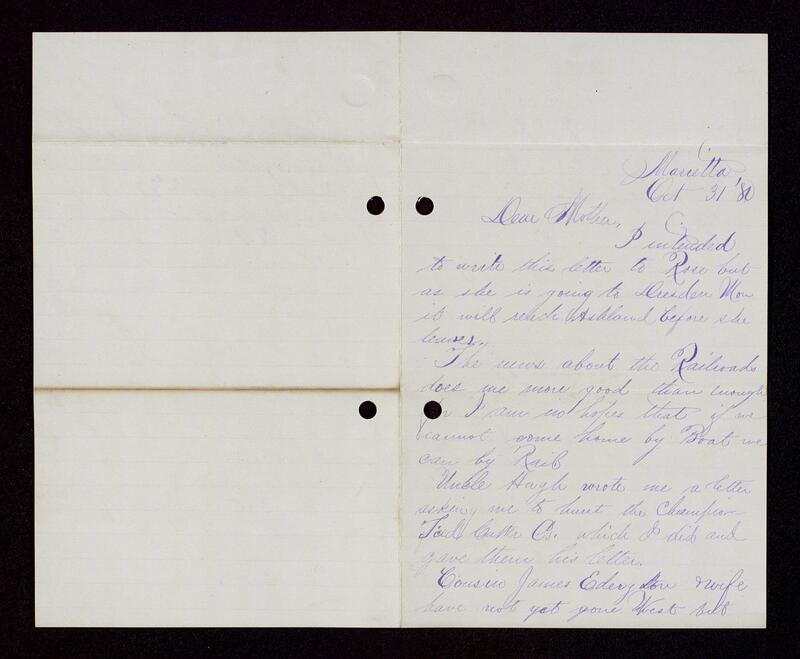 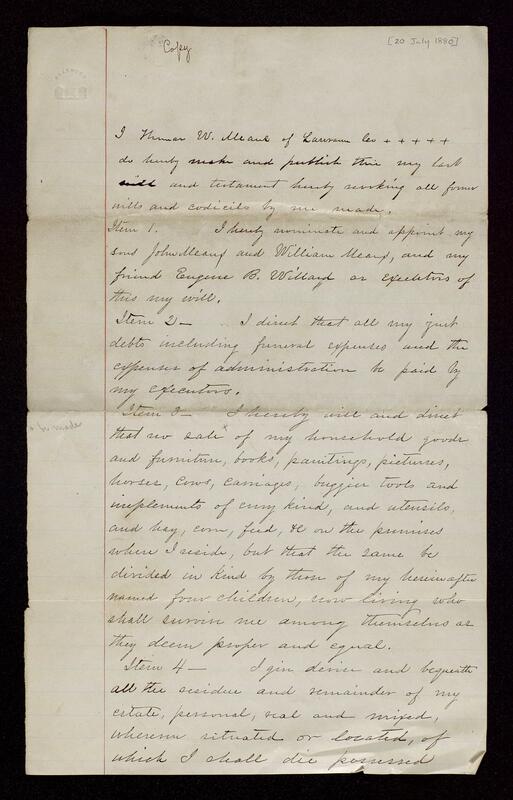 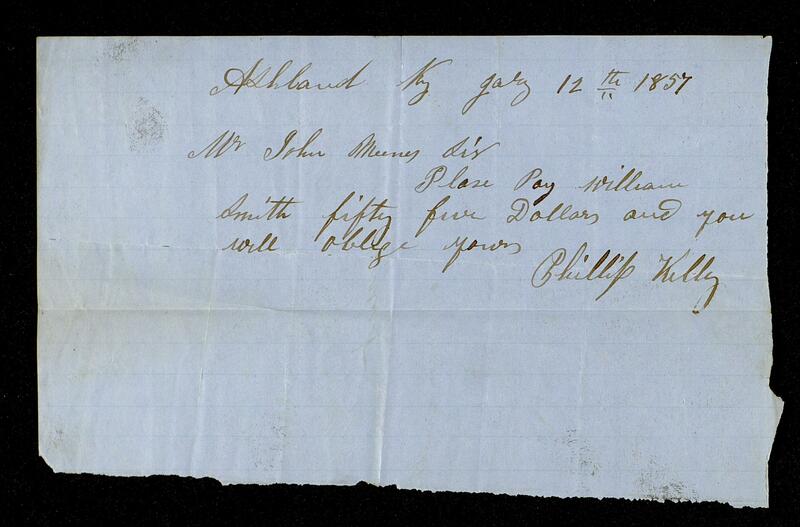 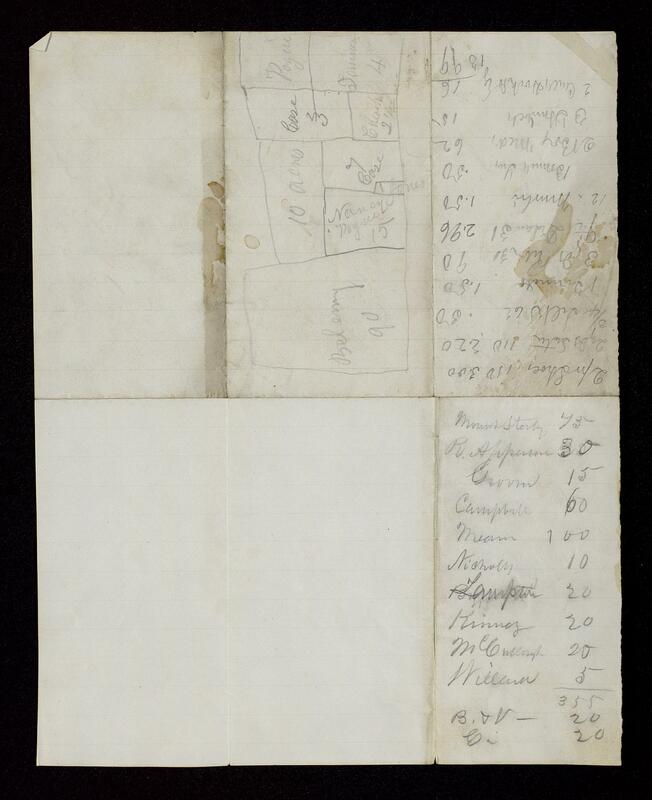 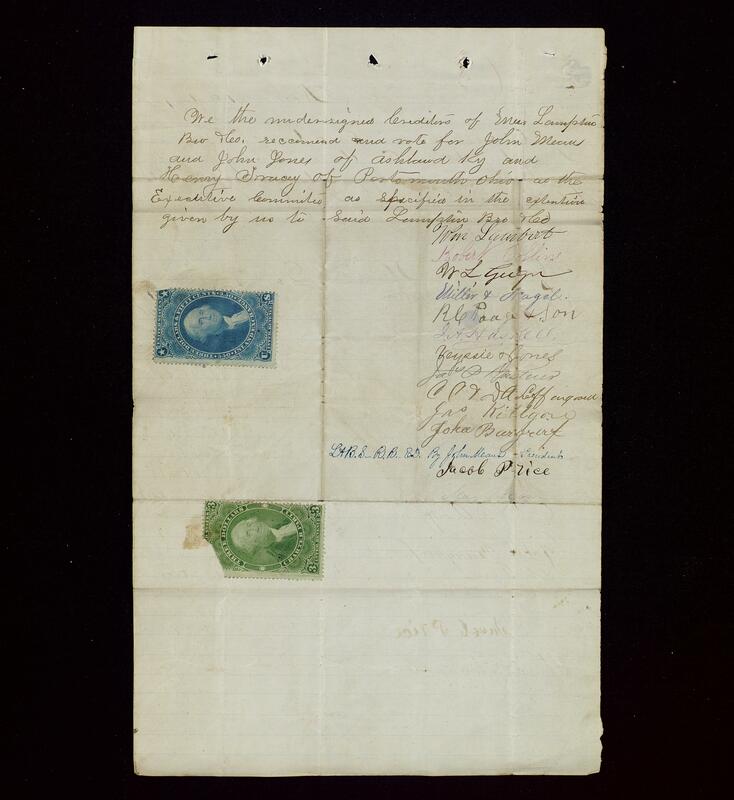 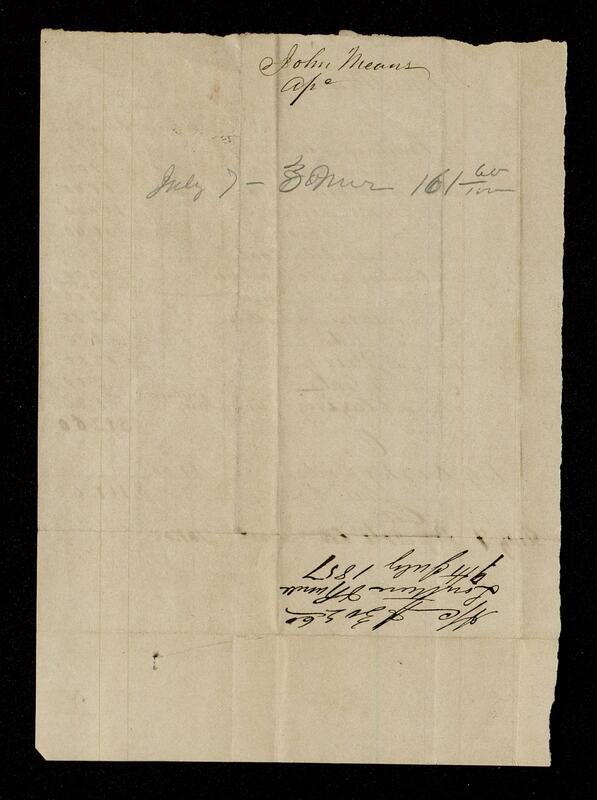 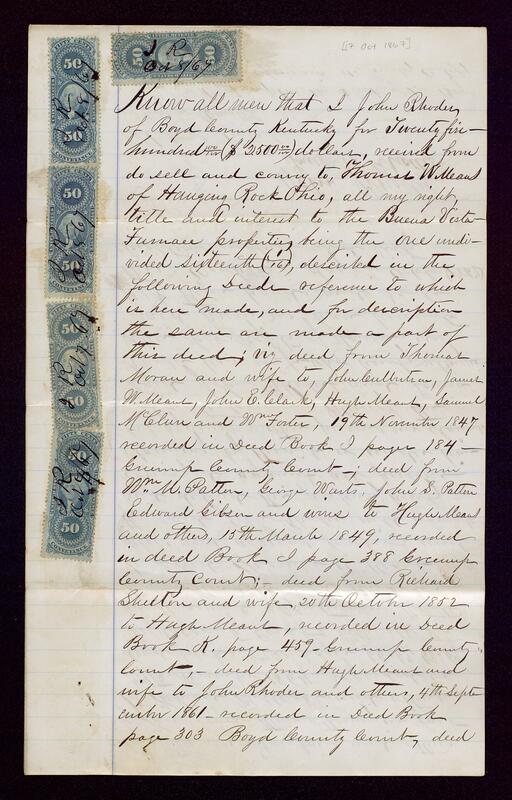 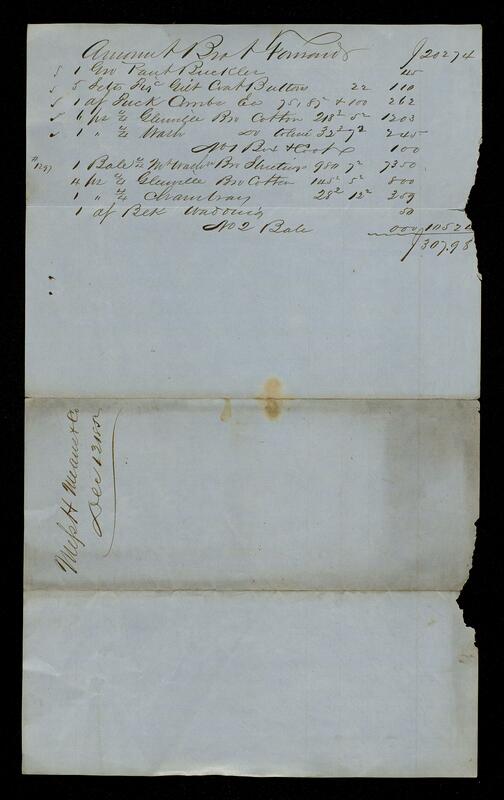 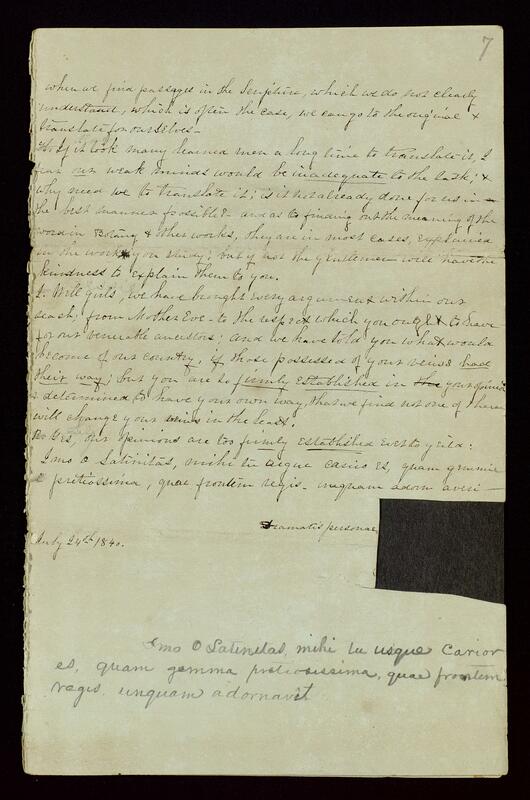 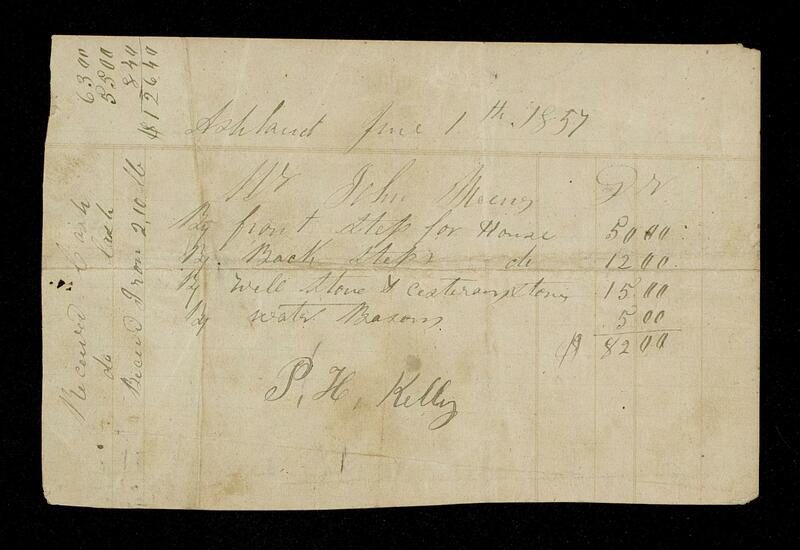 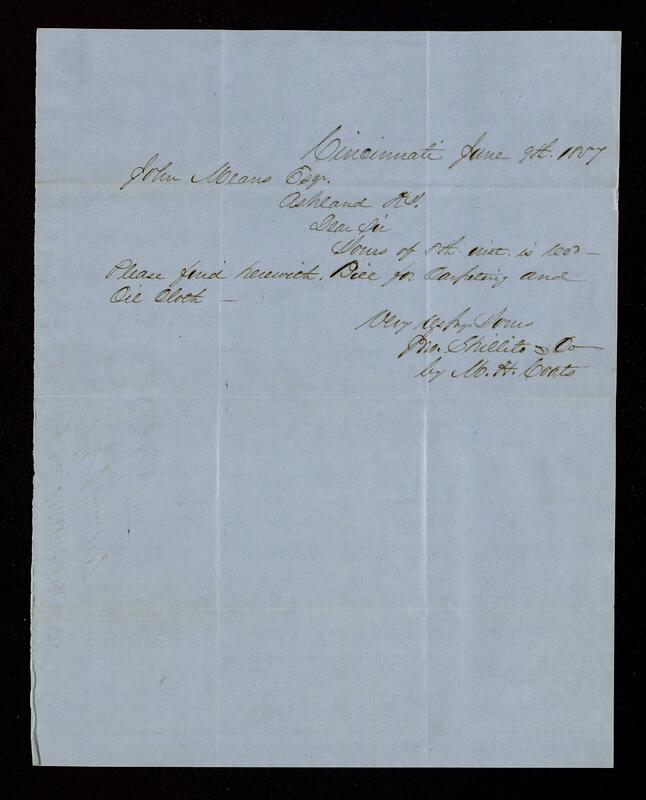 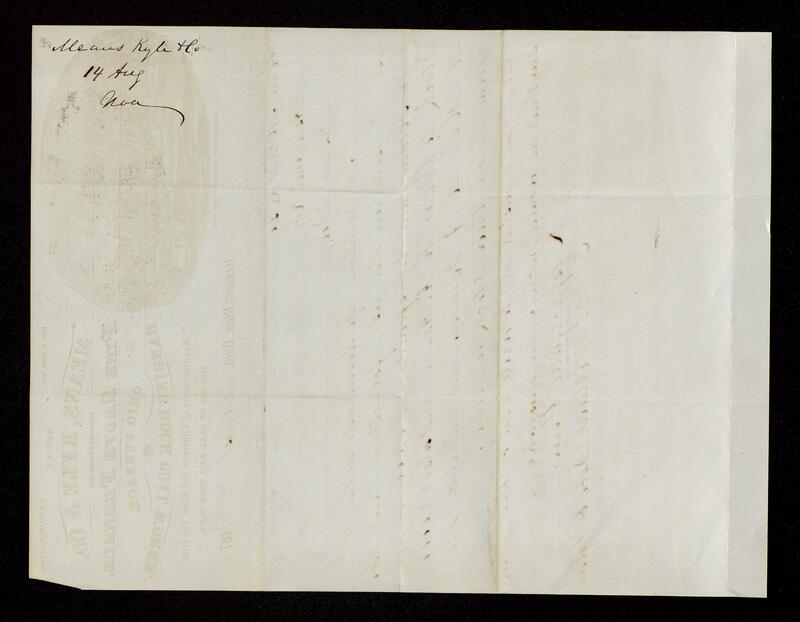 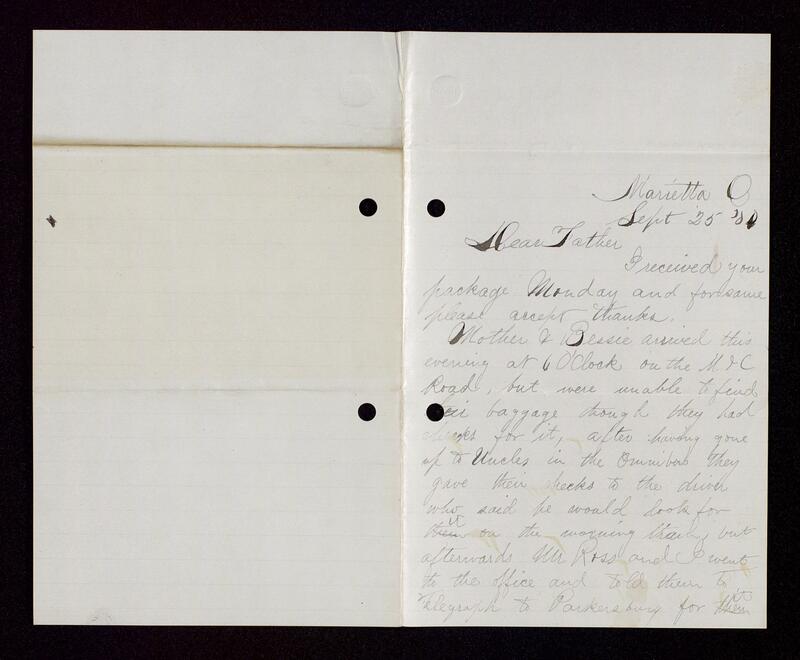 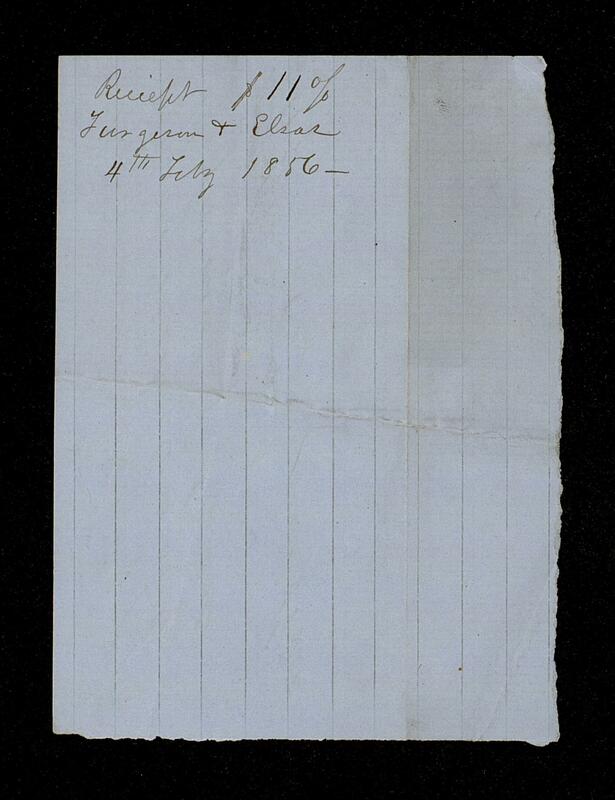 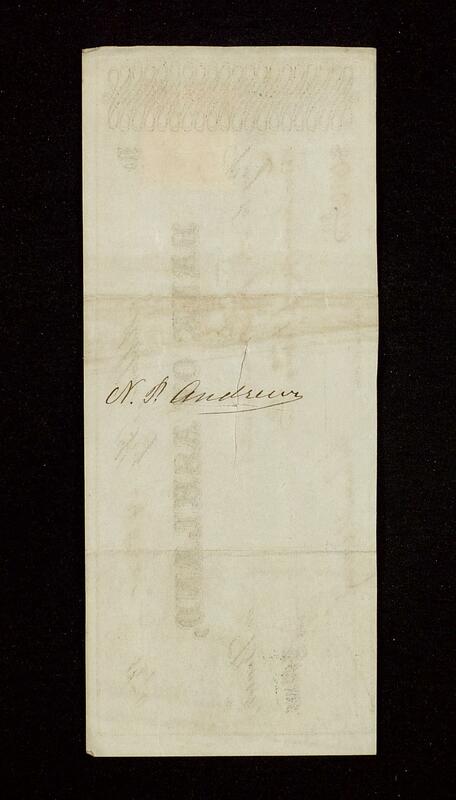 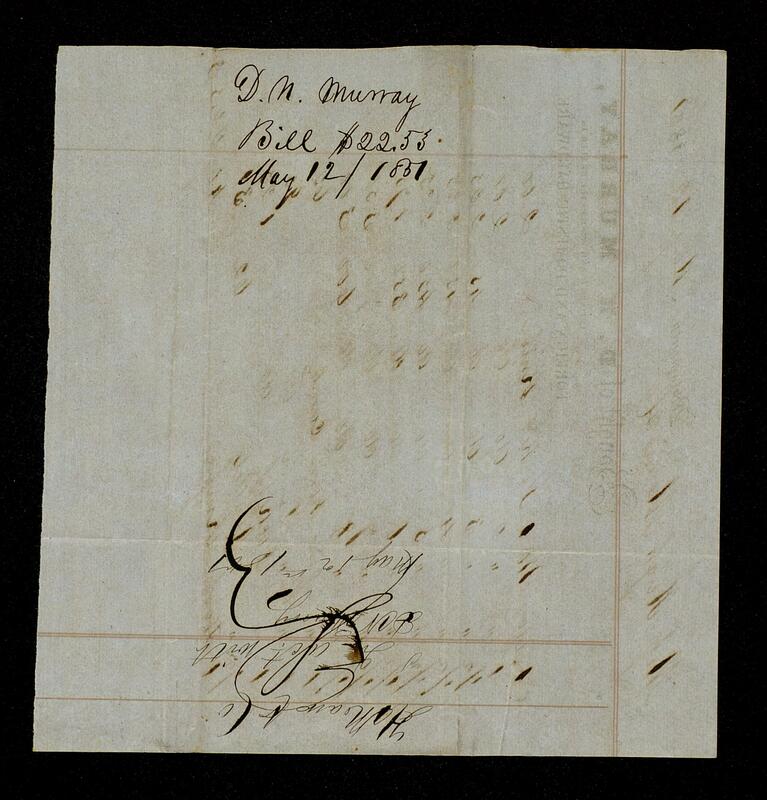 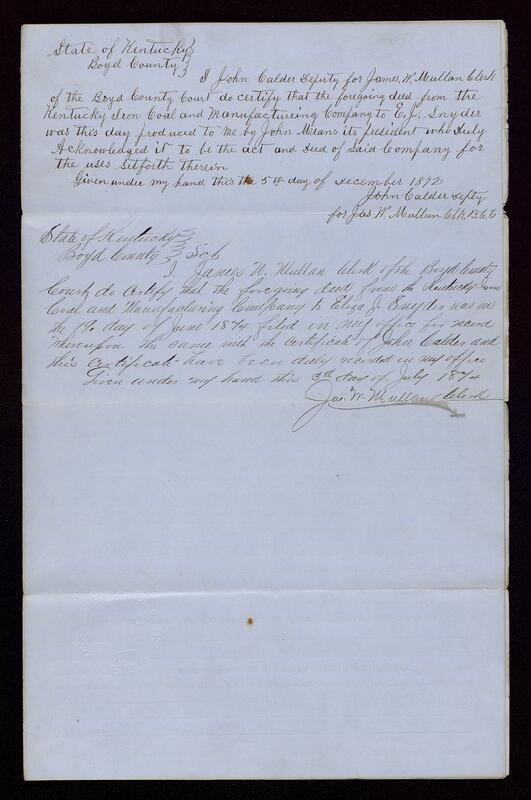 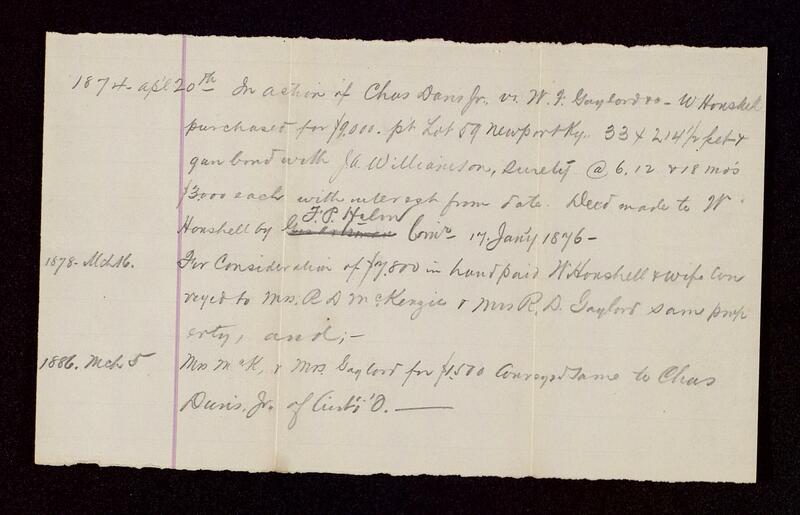 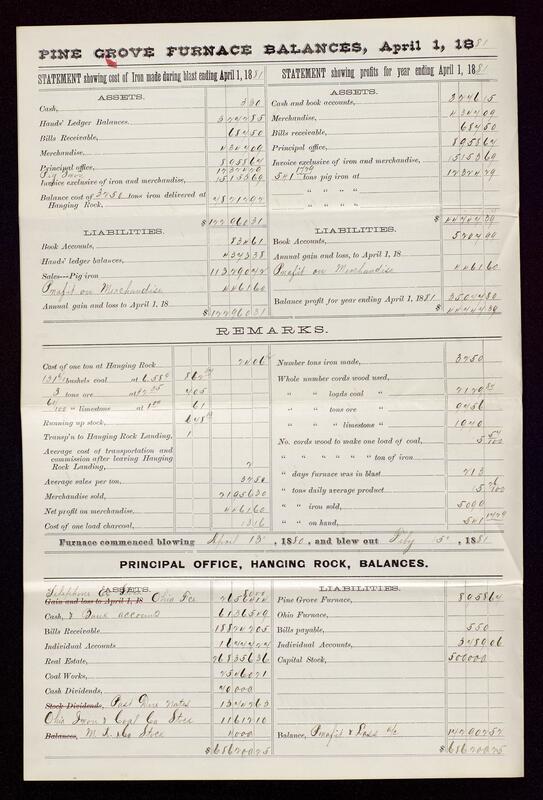 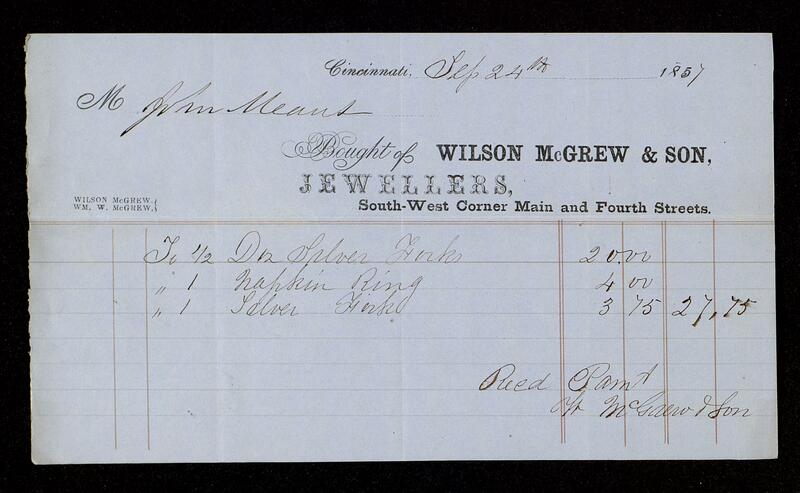 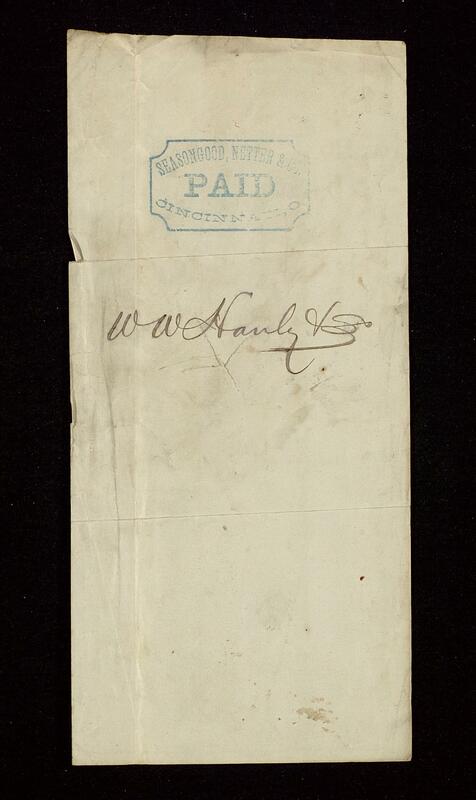 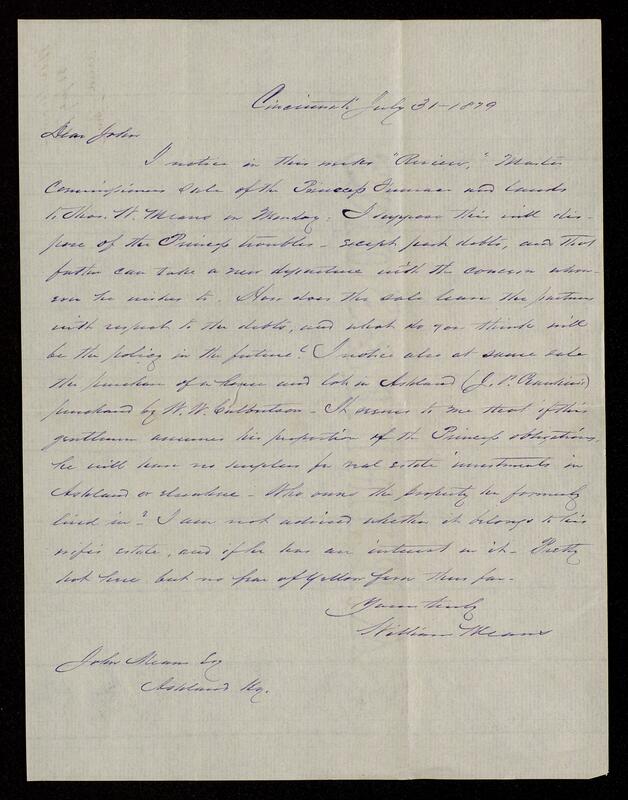 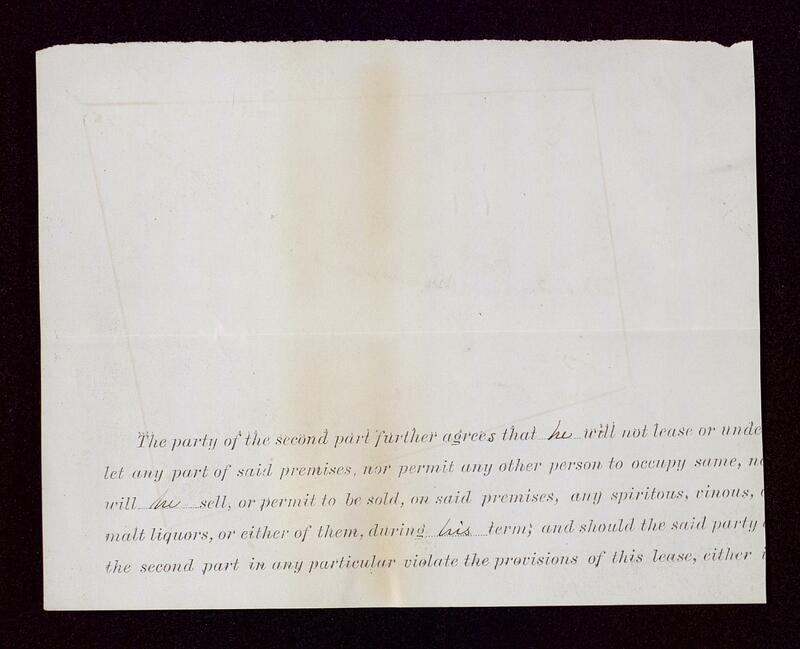 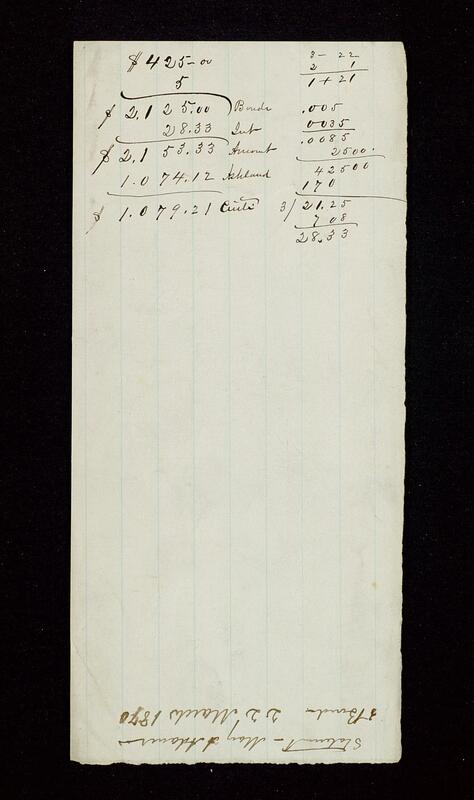 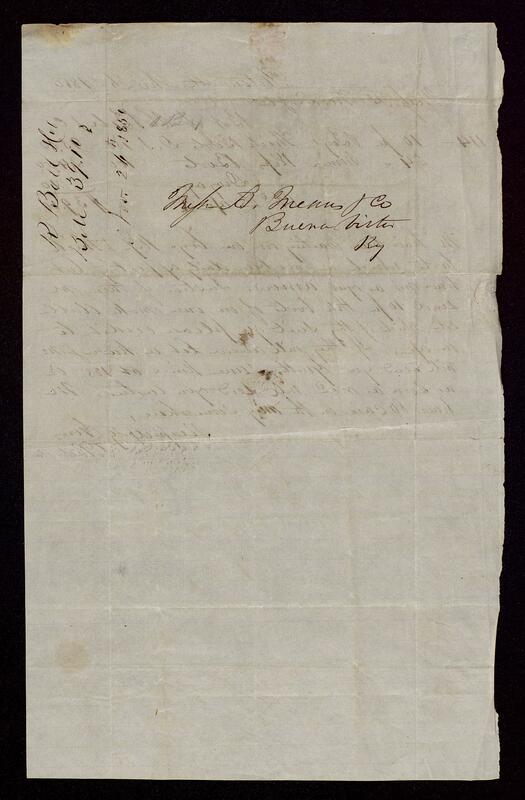 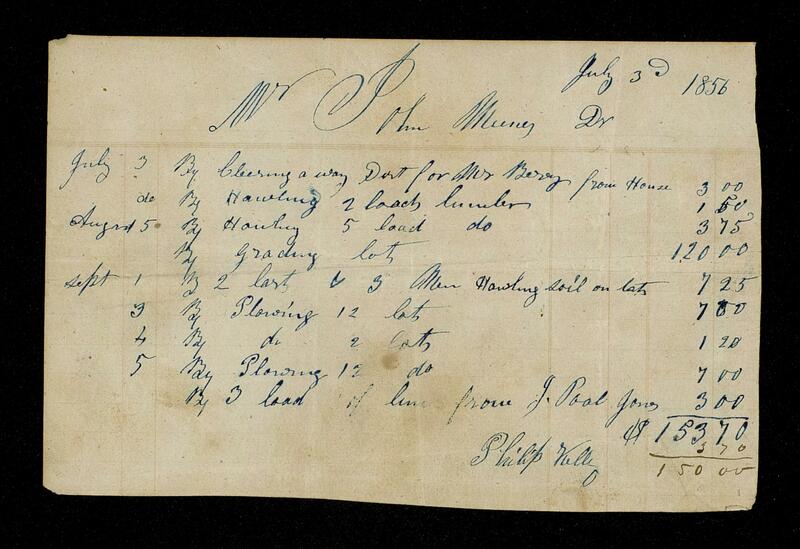 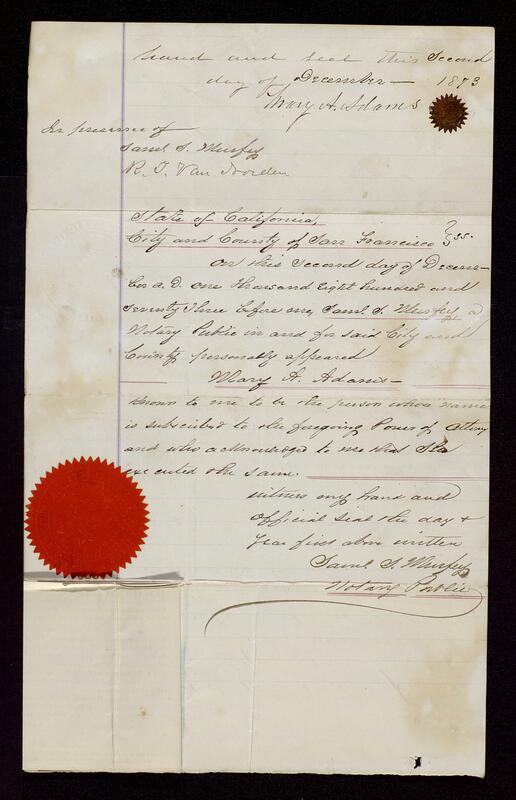 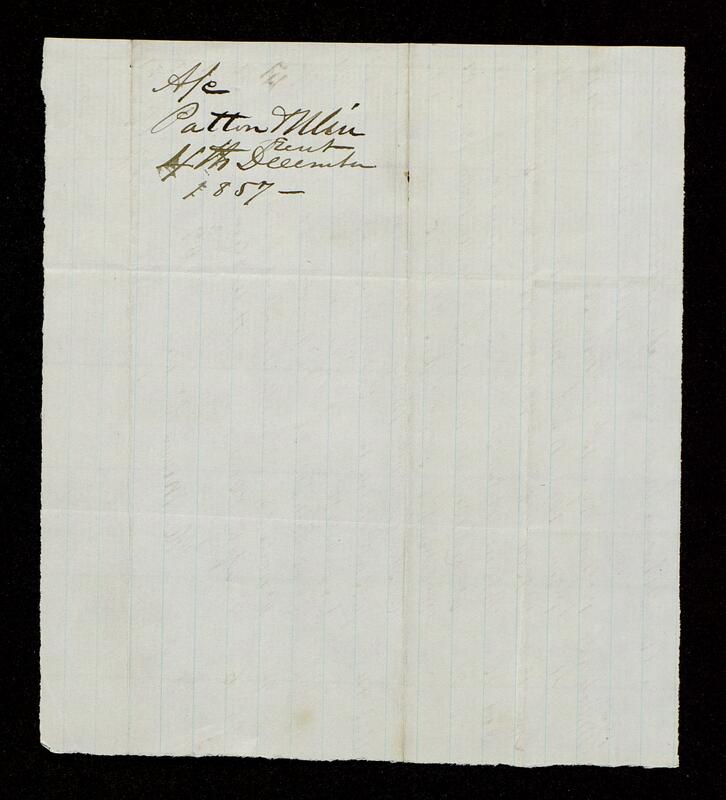 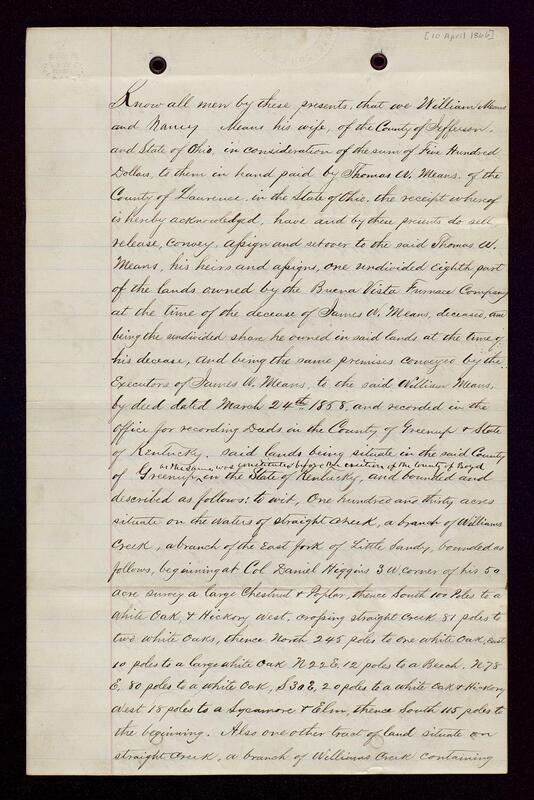 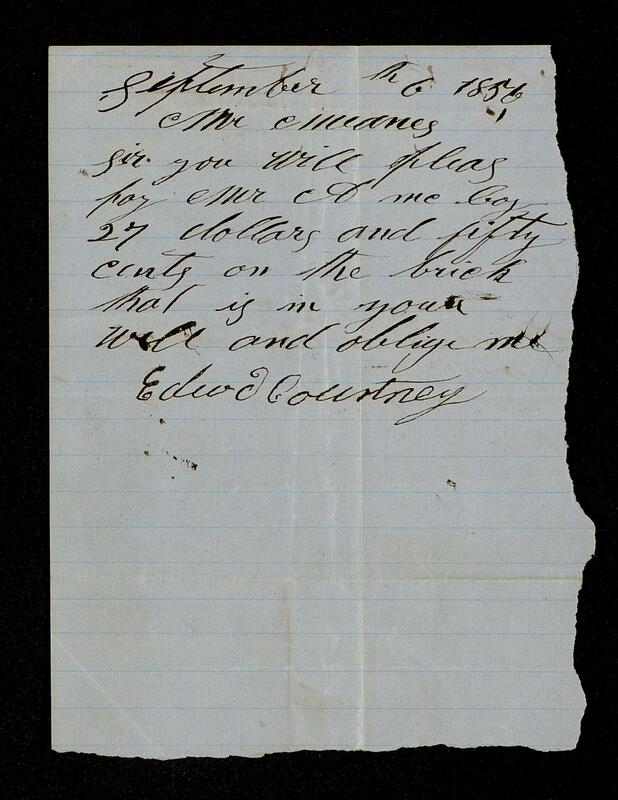 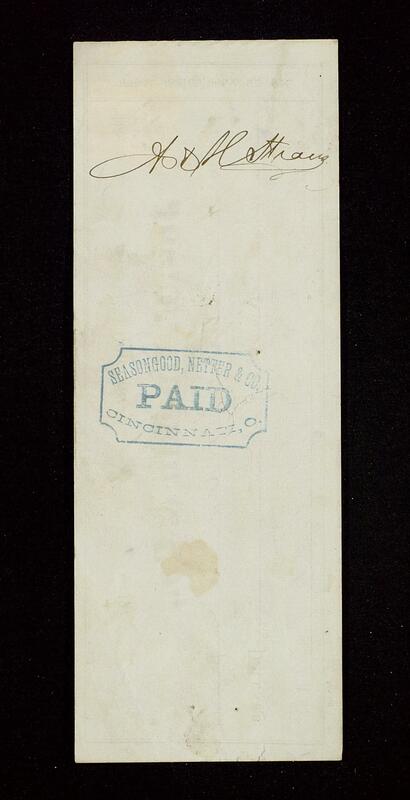 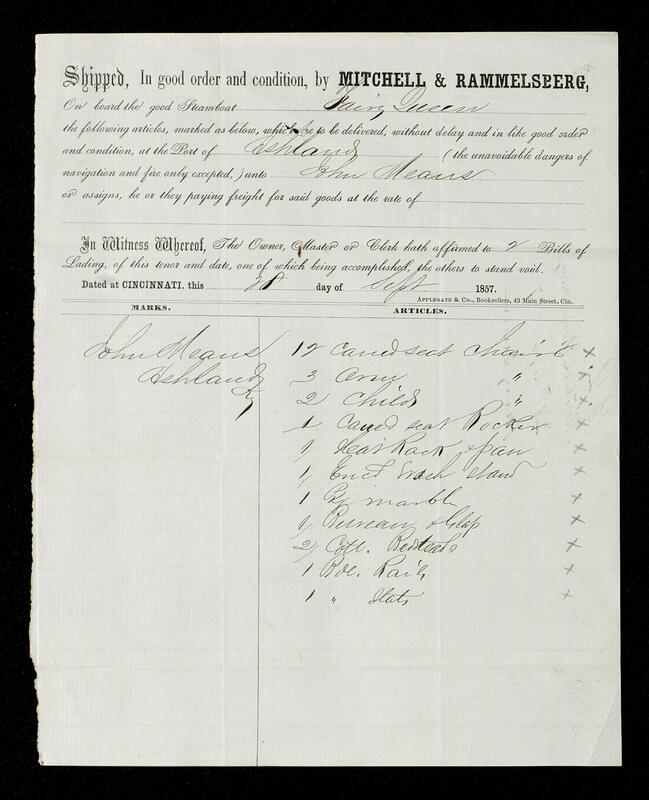 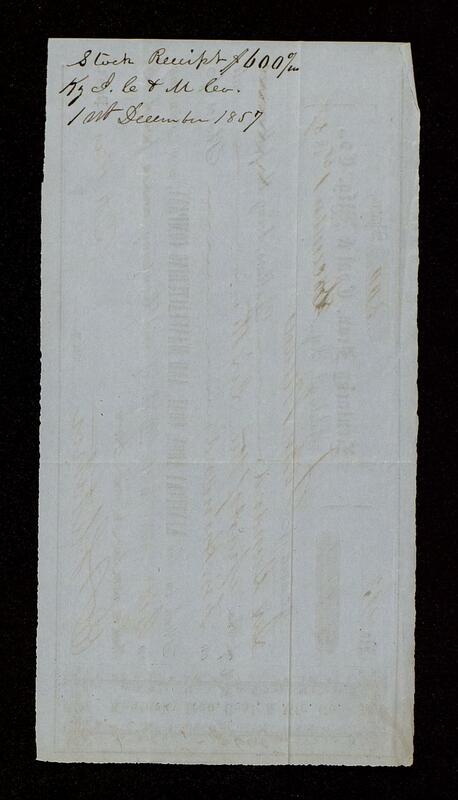 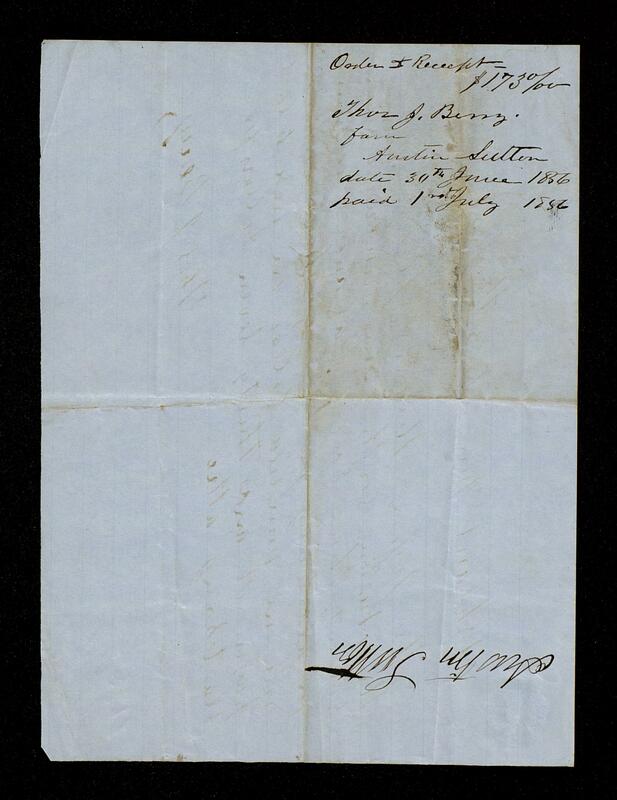 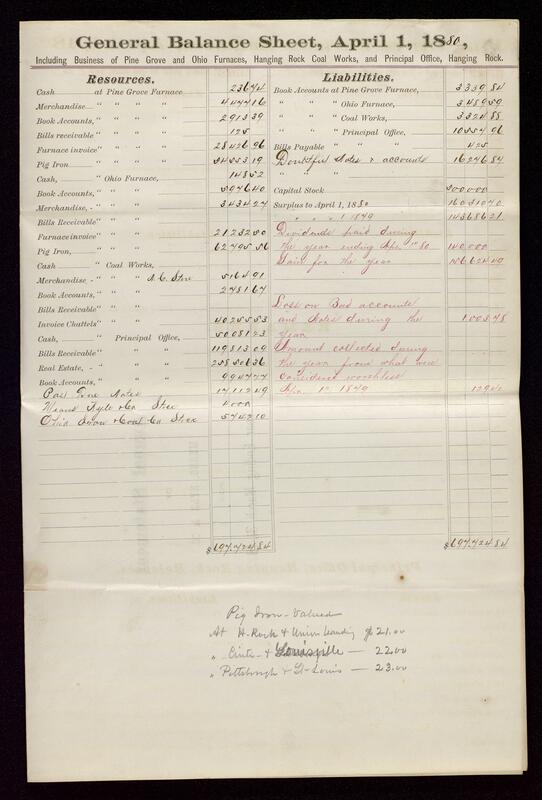 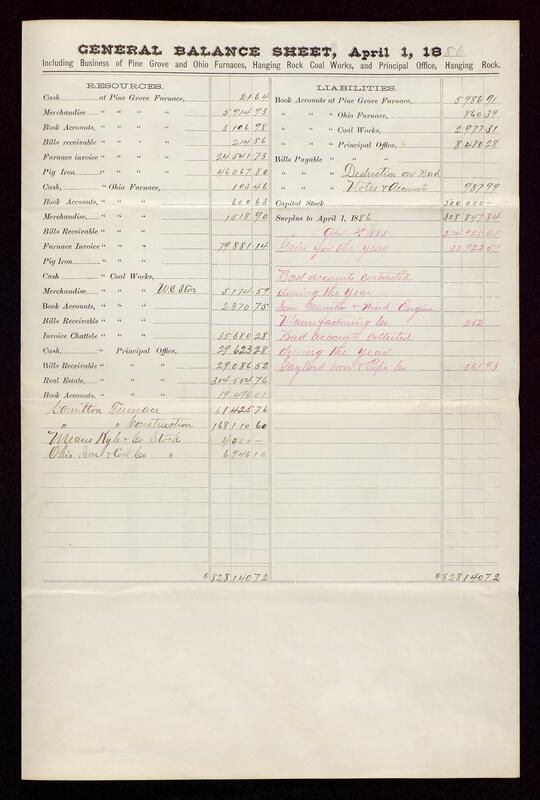 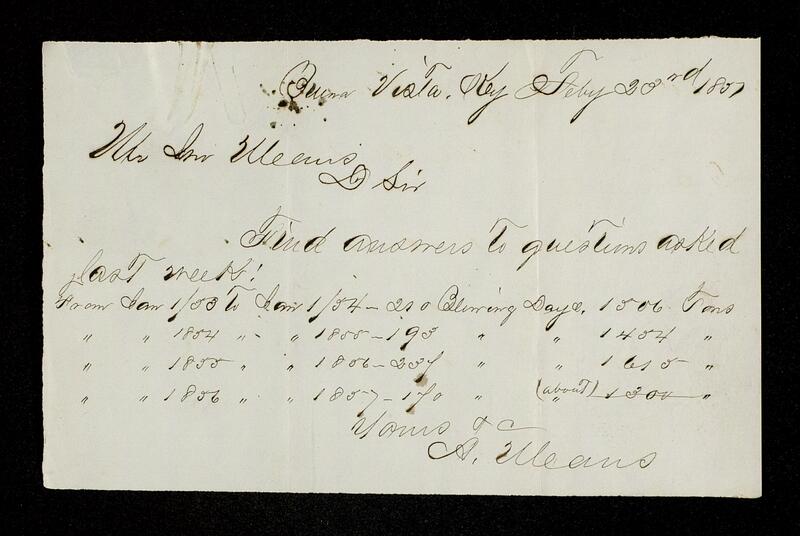 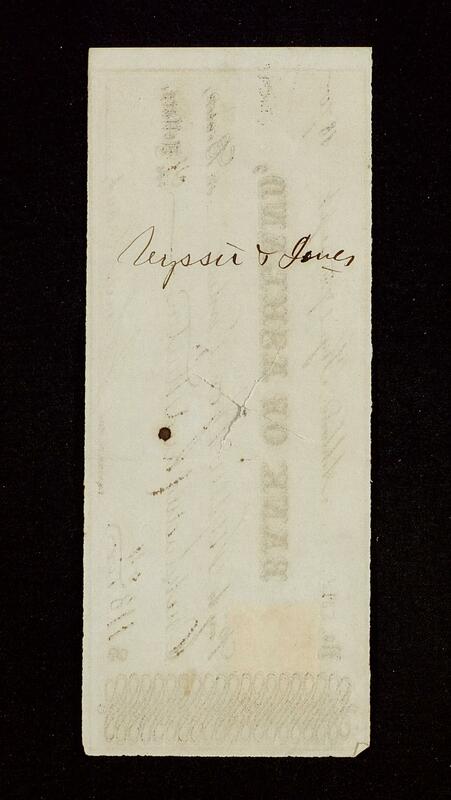 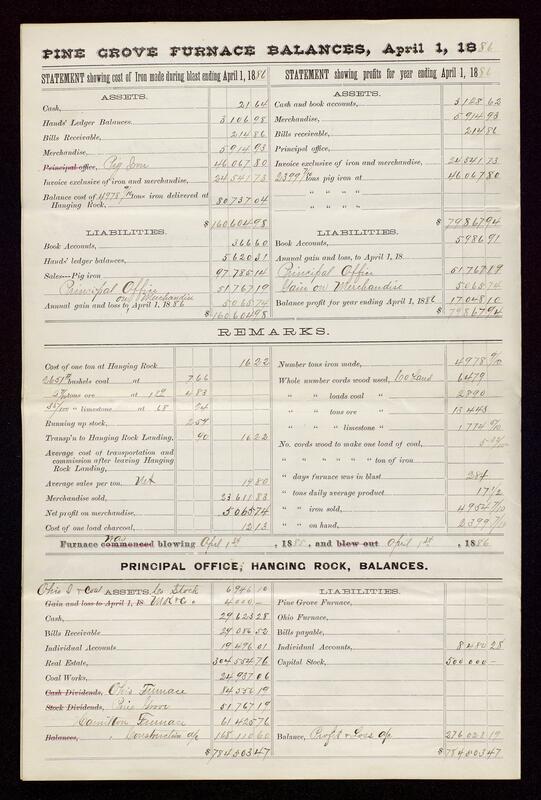 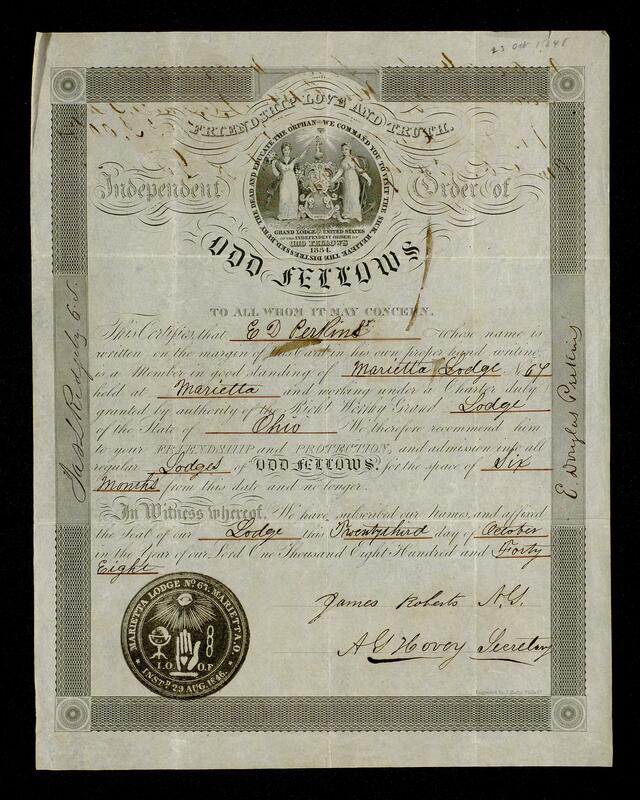 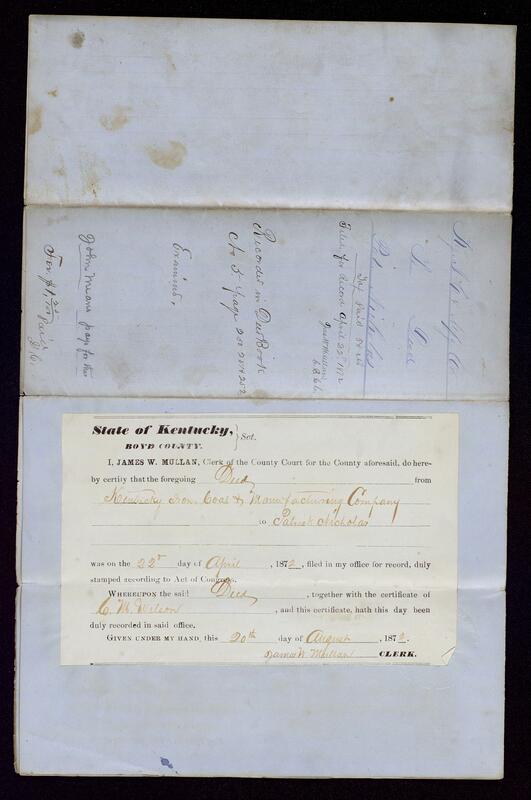 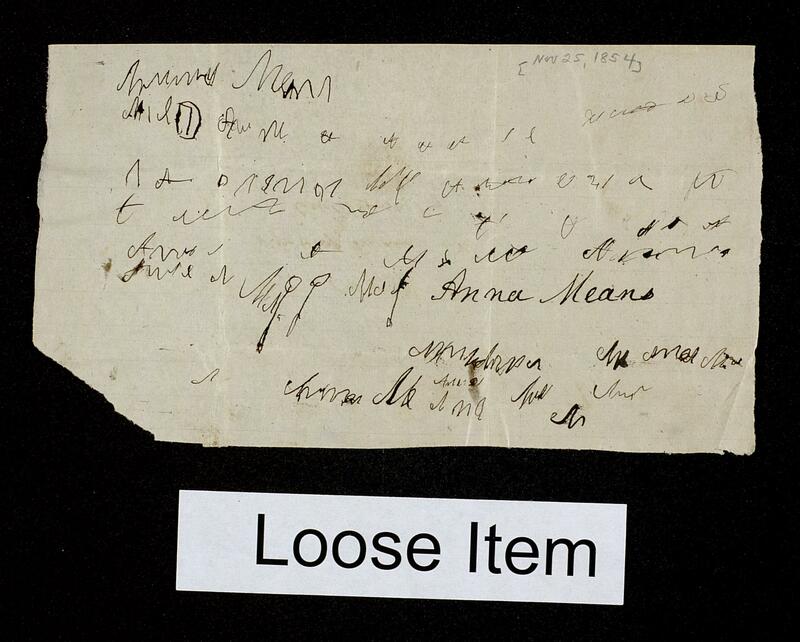 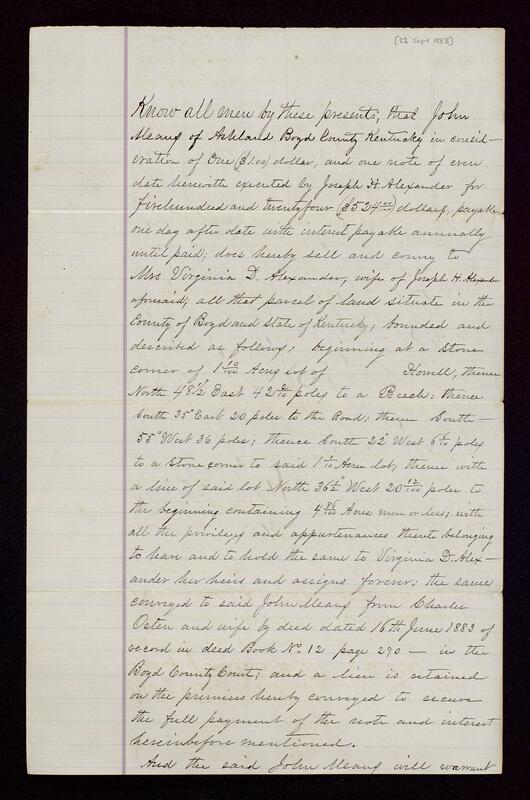 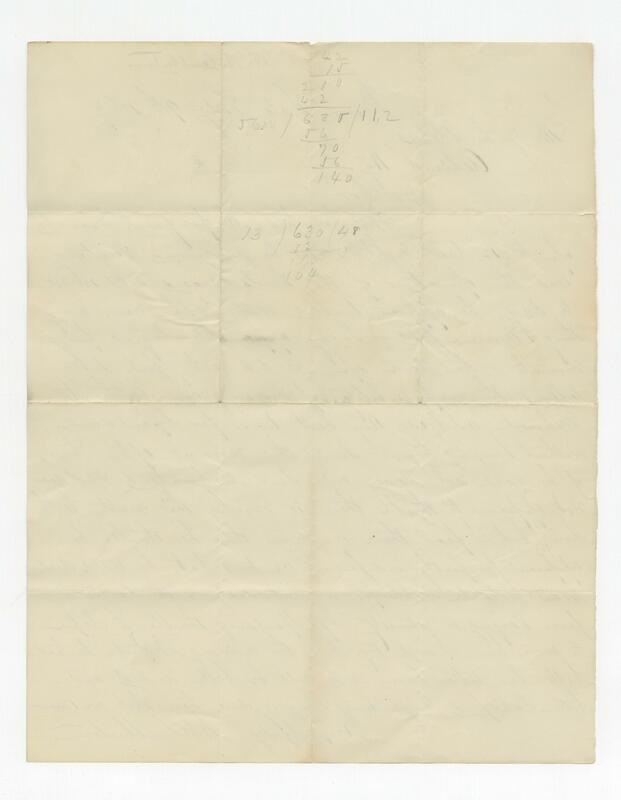 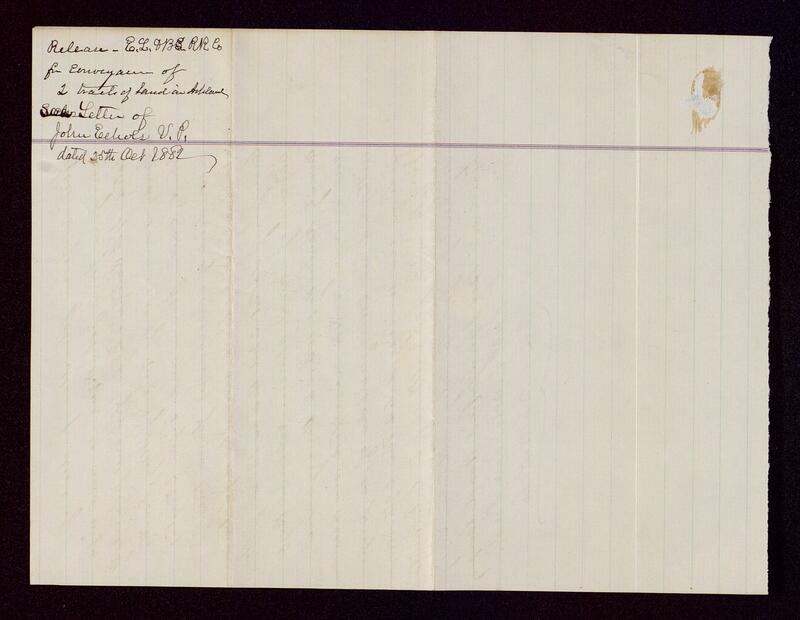 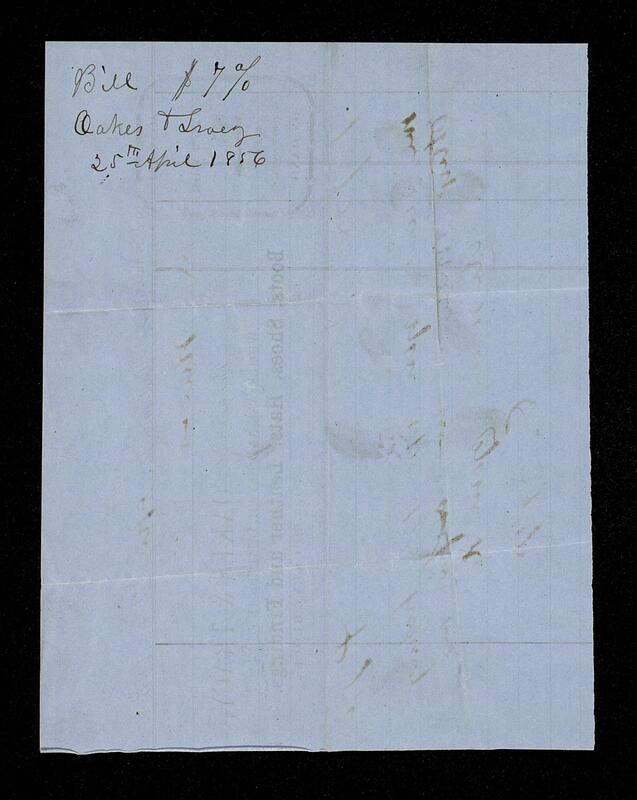 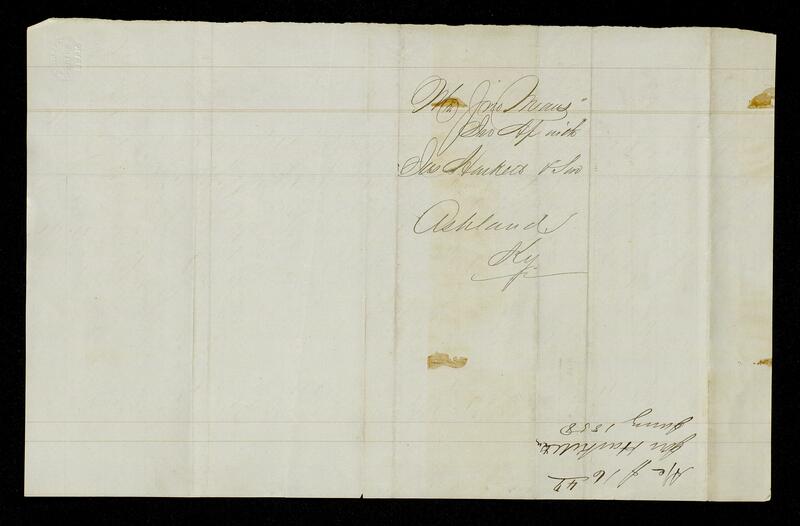 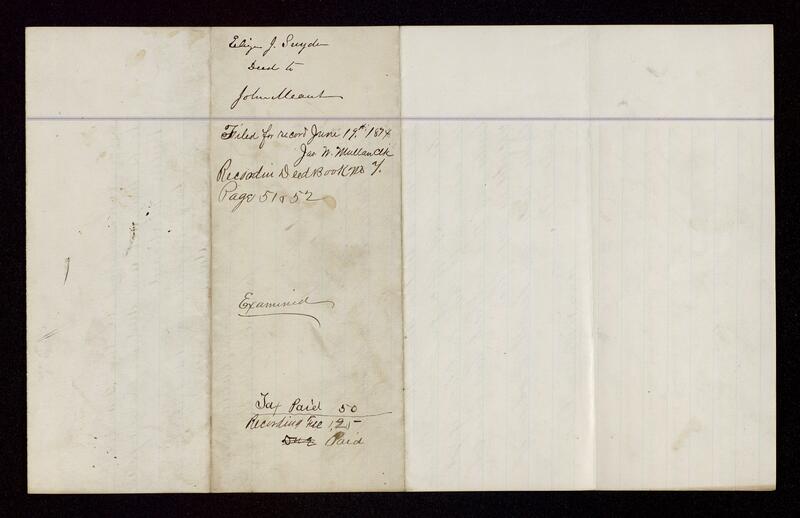 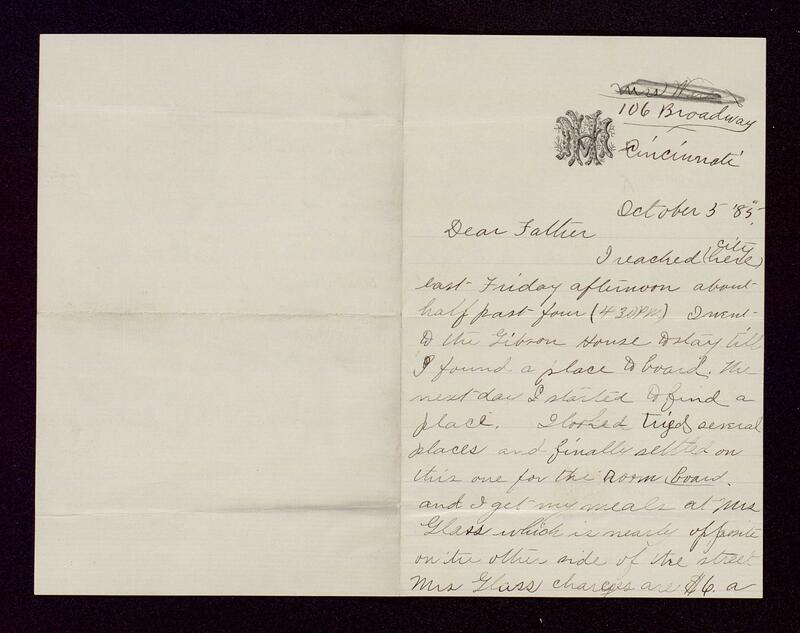 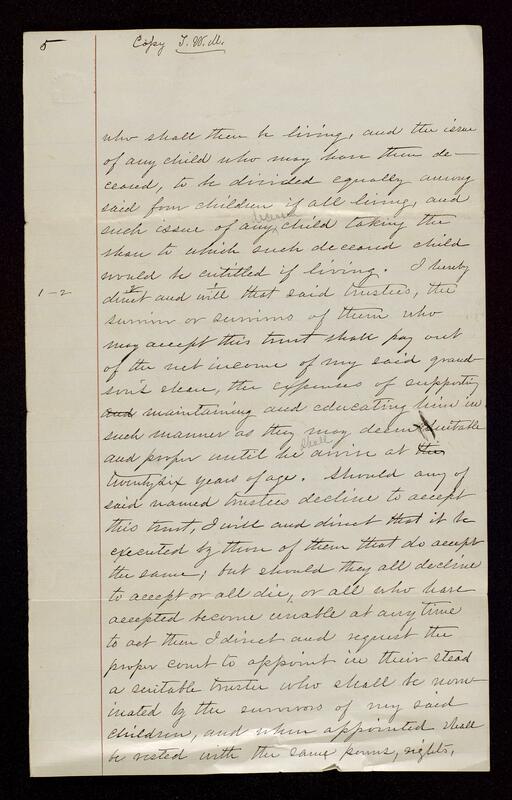 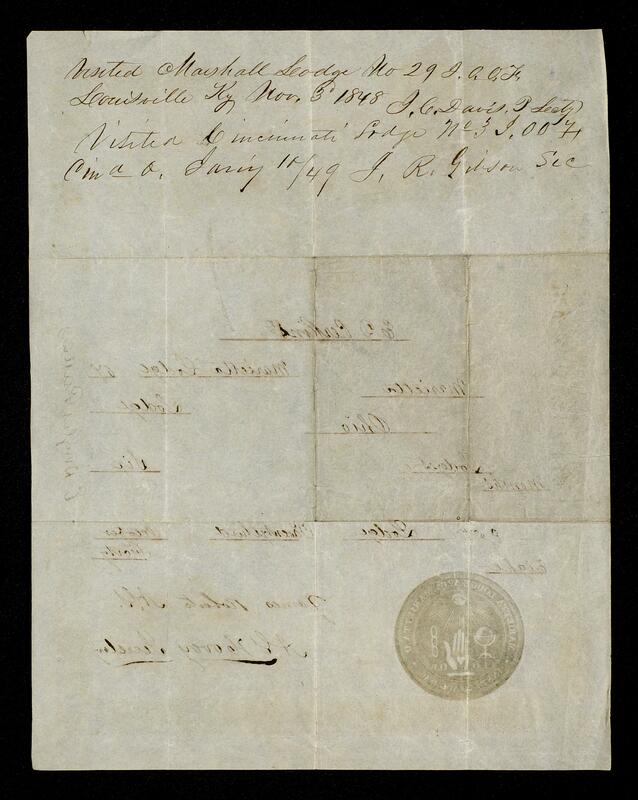 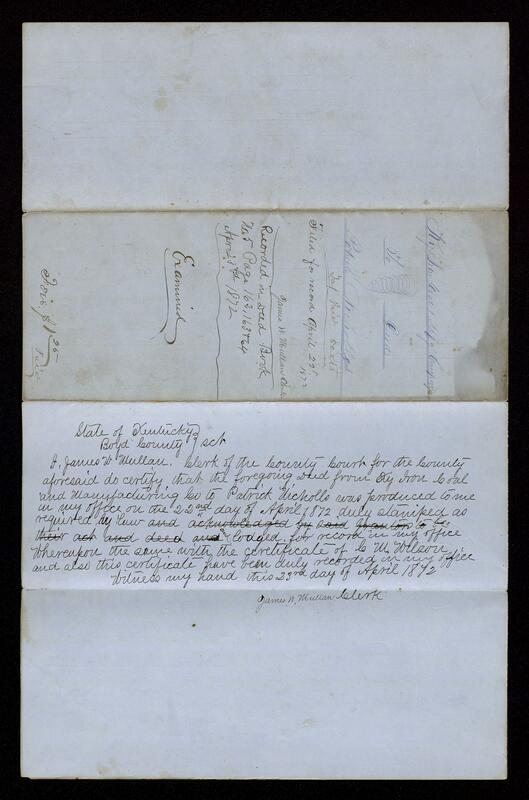 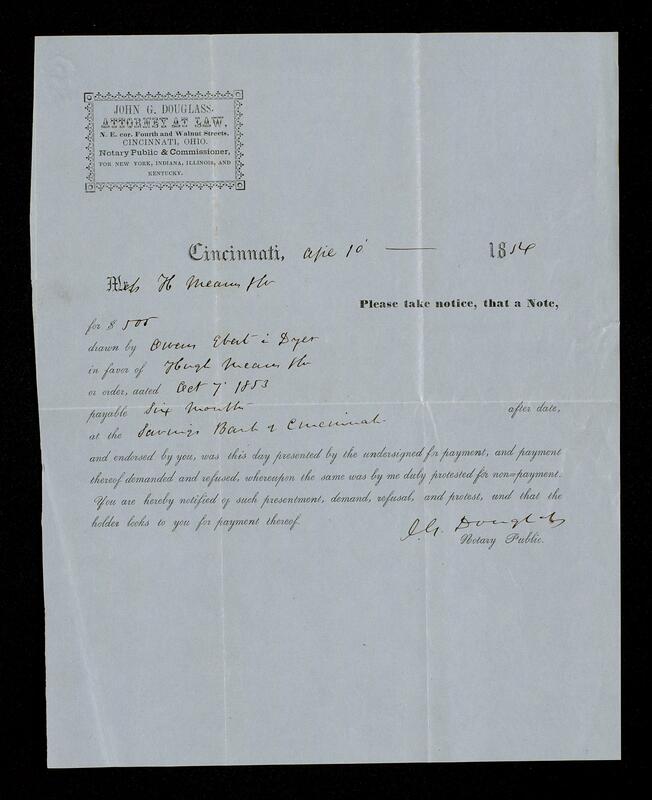 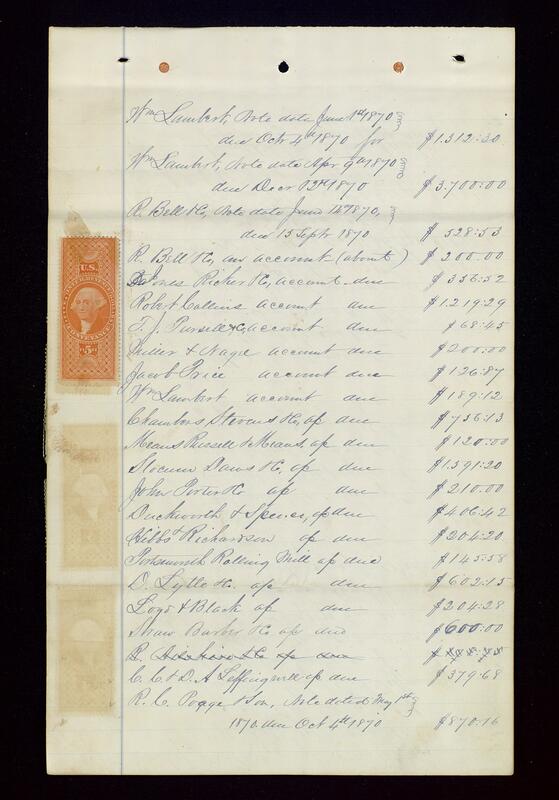 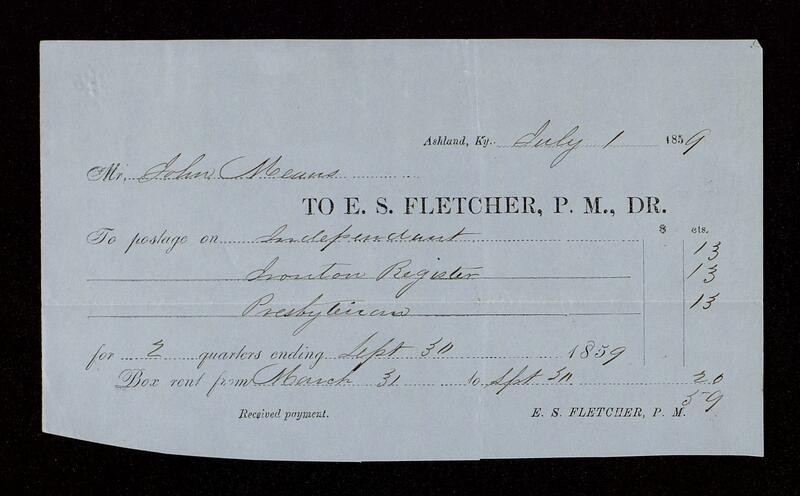 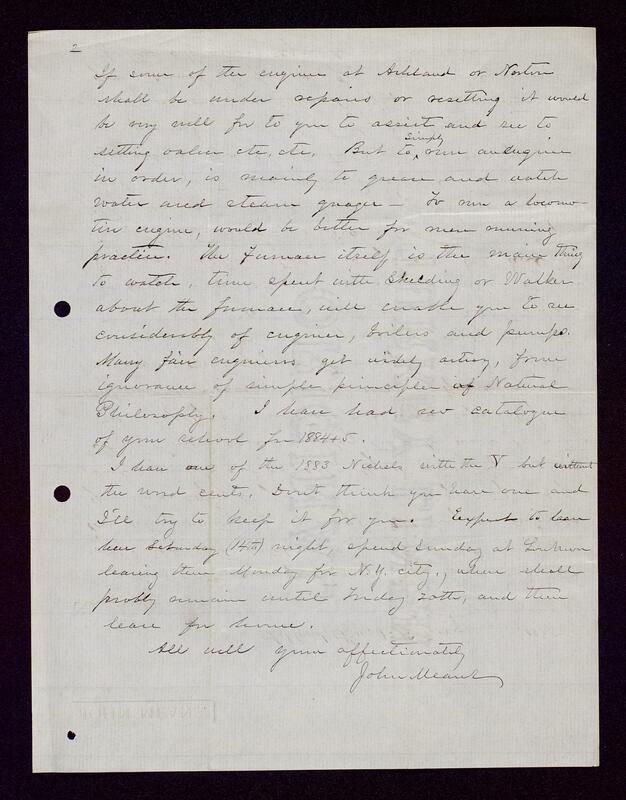 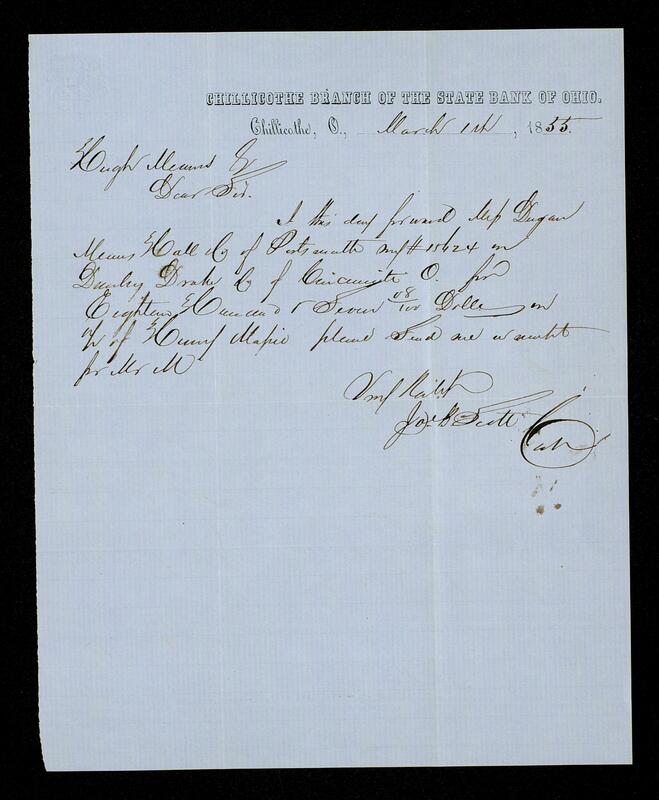 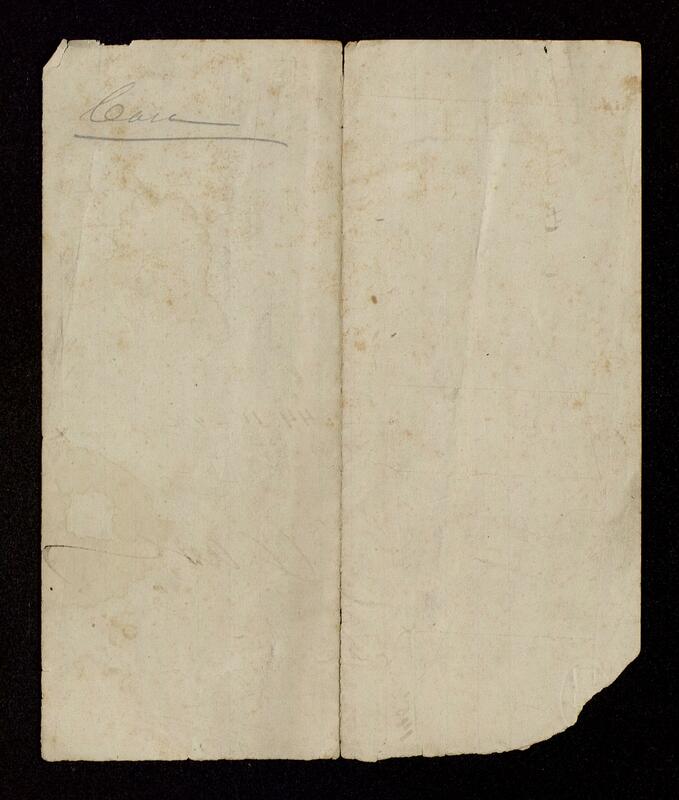 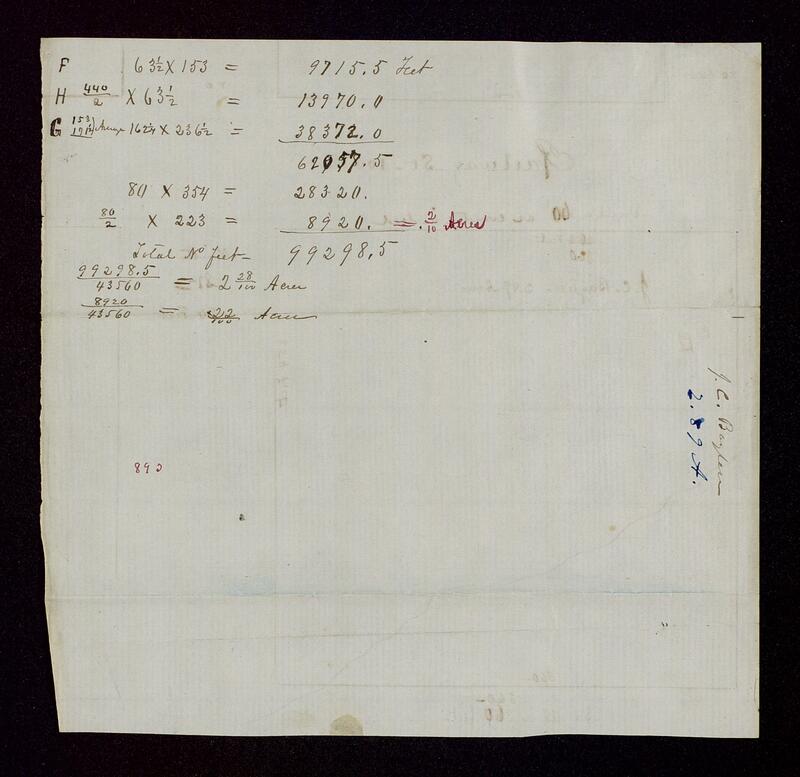 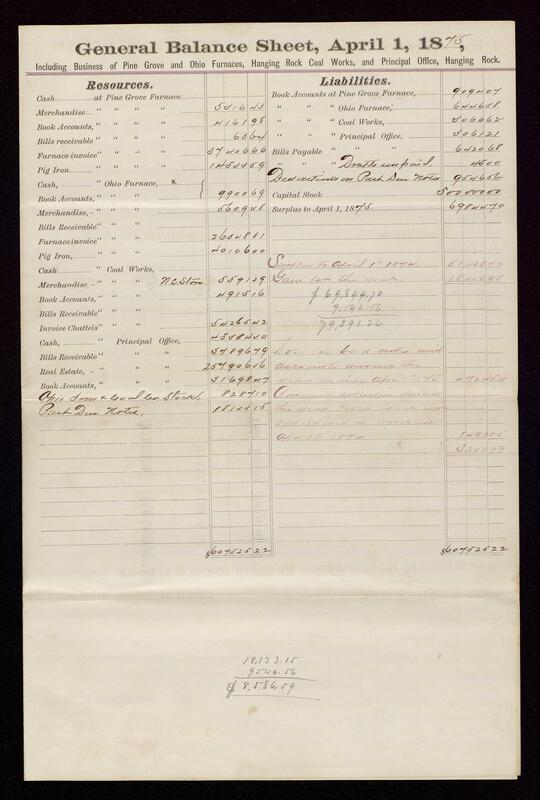 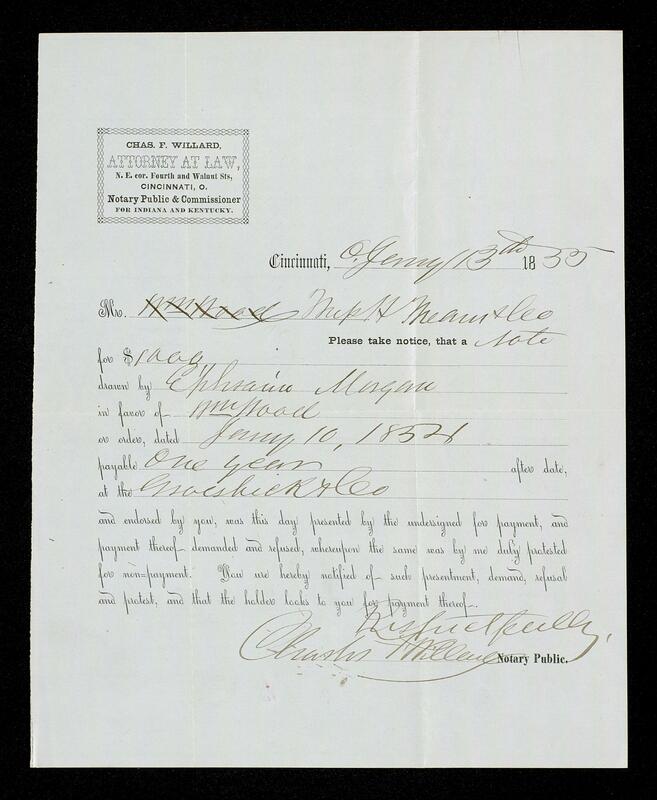 56M301 : [Identification of item], Means family papers, 1849-1954, University of Kentucky Special Collections. 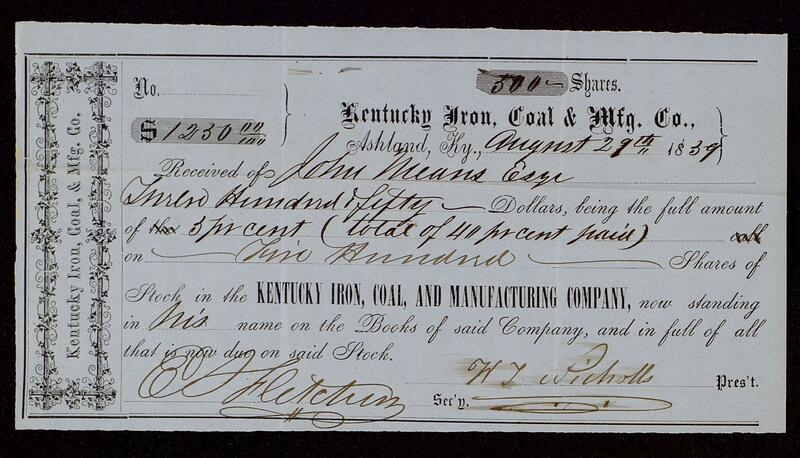 The Means family played a dominant role in the development of the iron industry in the Hanging Fork region of southern Ohio and in eastern Kentucky. They also played a prominent part in the development of both river and rail transportation in the area and in the formation of Ashland, Kentucky as an industrial city. 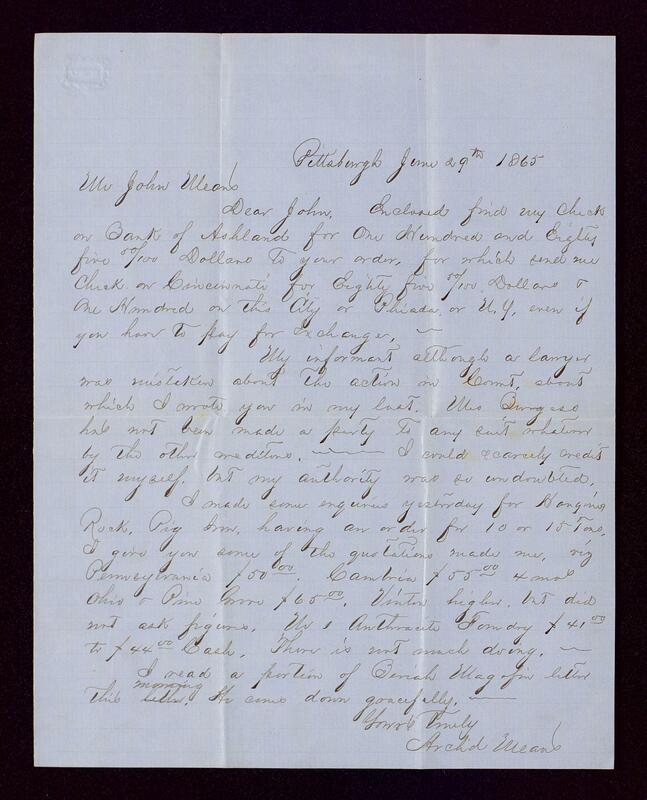 John Means' grandfather, Colonel John Means, was a wealthy South Carolina upcountry planter, who migrated from Bucks County, Pennsylvania and settled in the Union District of South Carolina (Spartanburg). 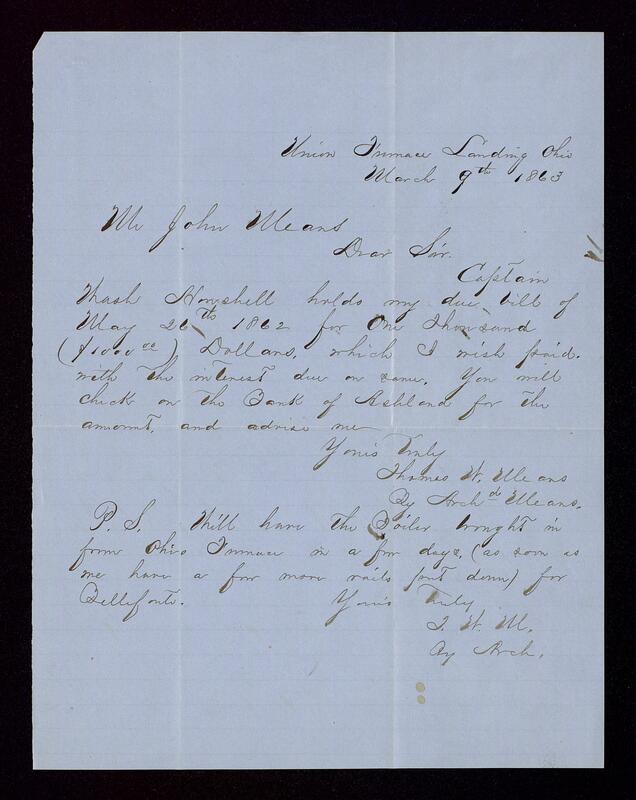 Though a slaveholder, Means had little sympathy for the institution and in 1819 he migrated to Manchester, Adams County, in southern Ohio, where he granted freedom to his twenty-five slaves. 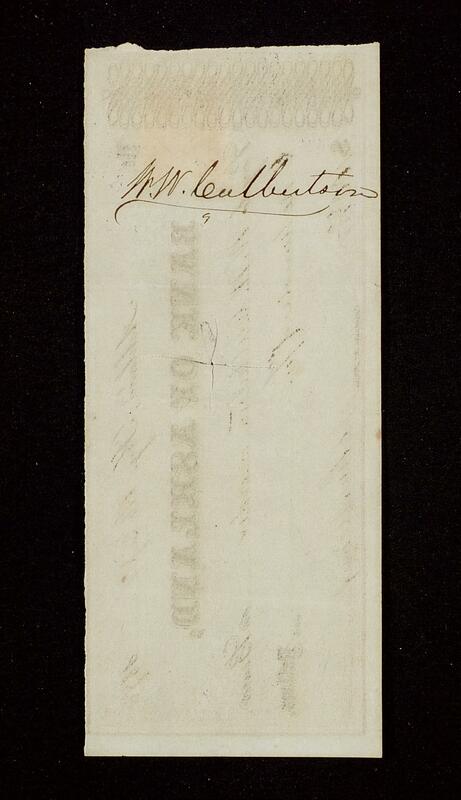 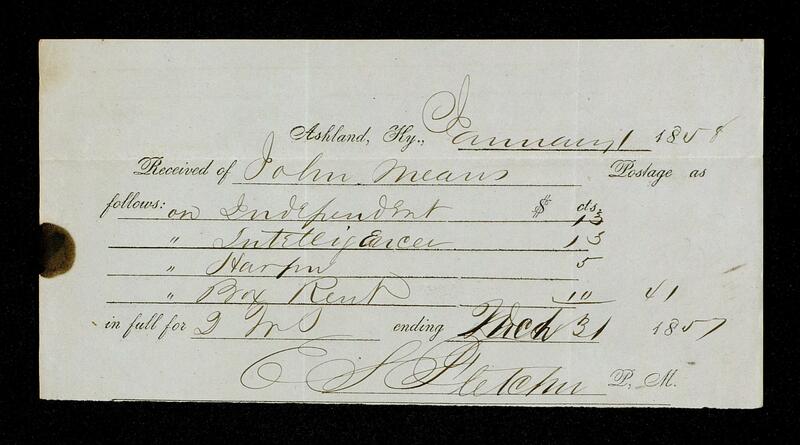 In Ohio, he engaged in farming and was a land agent of Albert Gallatin. 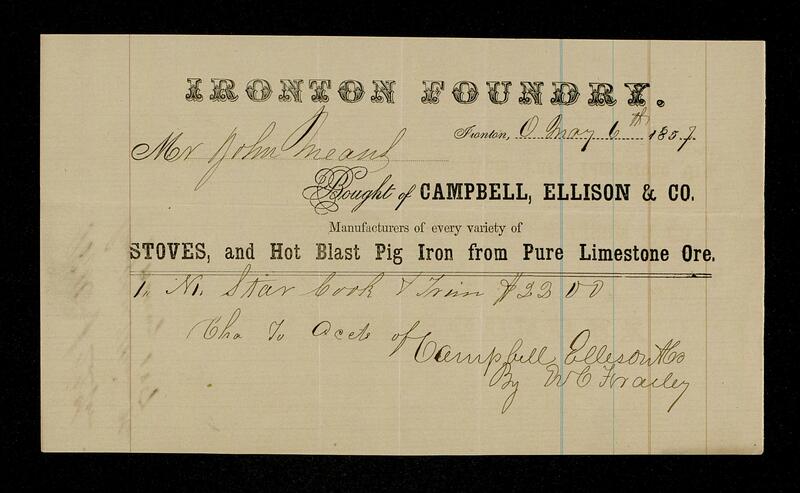 He also built and operated of one of the first iron furnaces in the Hanging Rock region. 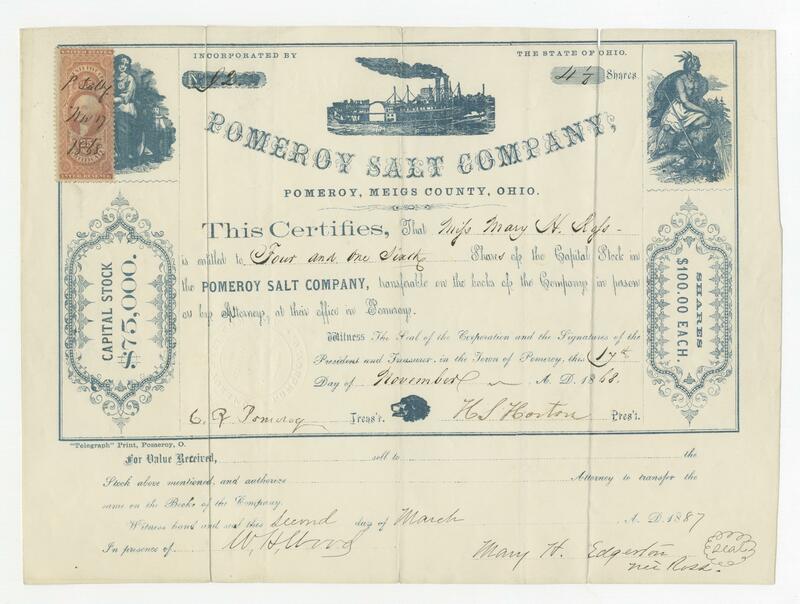 His son, Thomas W. Means, after a brief apprenticeship as a store keeper at Union Furnace, Ohio, formed a partnership in 1837 with David Sinton and took over operation of the furnace. 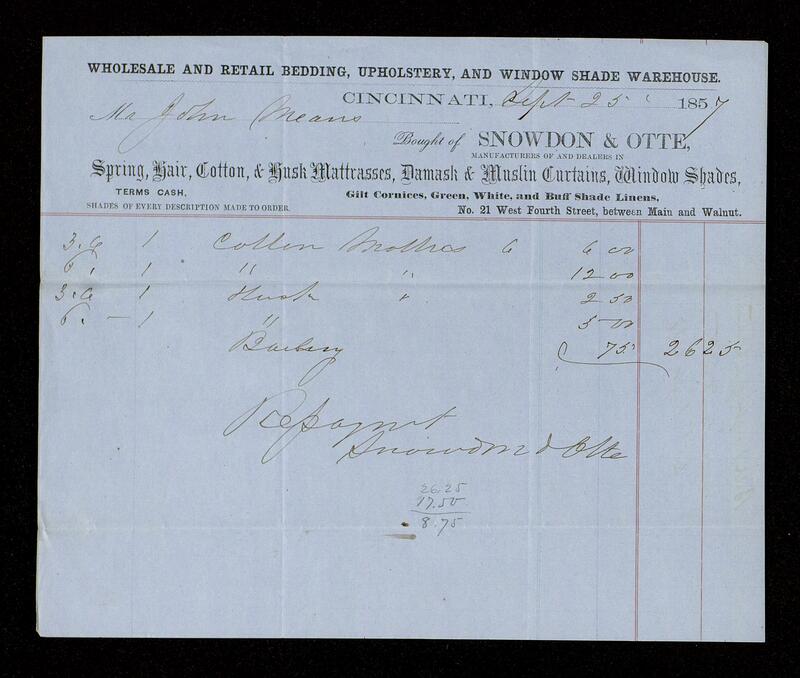 Throughout the 1840s and 1850s, Means and Sinton came into control of several furnaces in southern Ohio and eastern Kentucky. 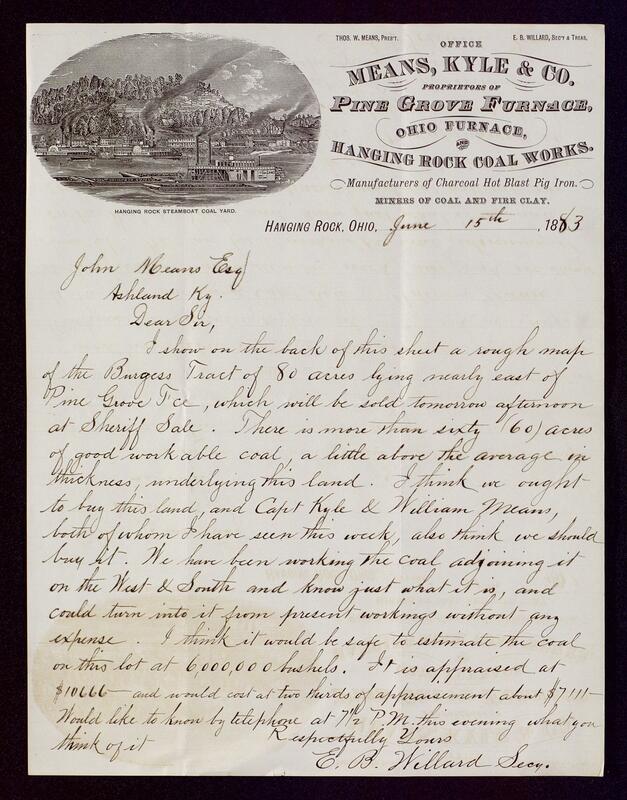 The Ohio Furnace, purchased in 1847, was reportedly the first charcoal furnace in the country to produce as much as tens tons of iron a day. 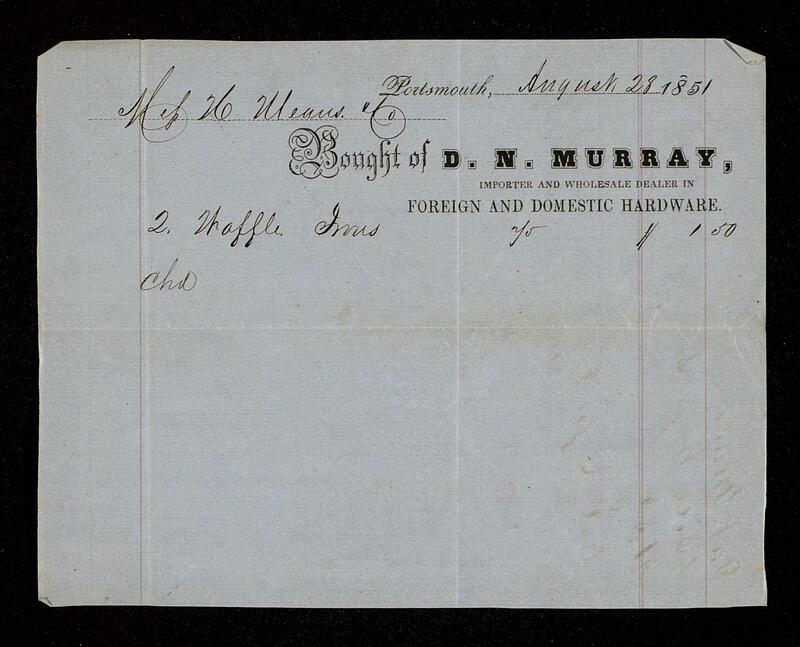 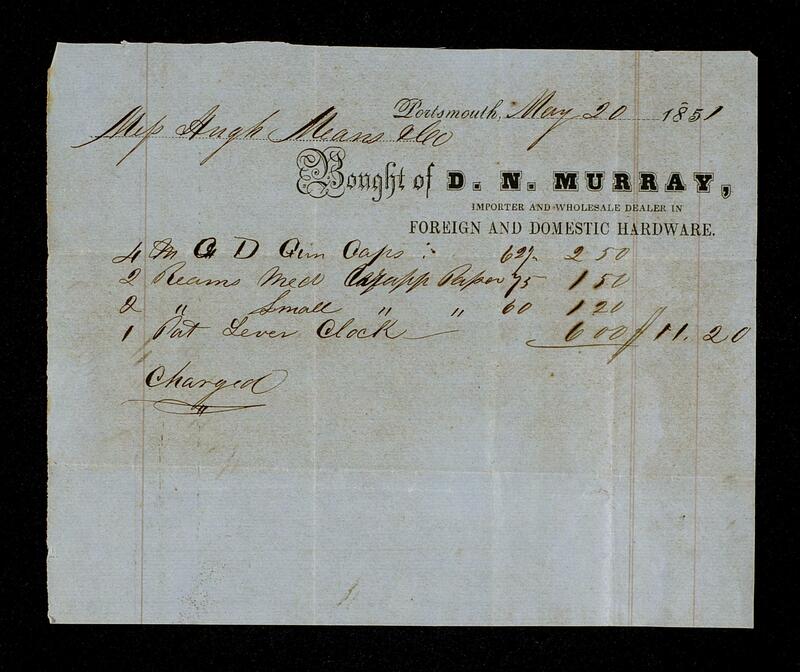 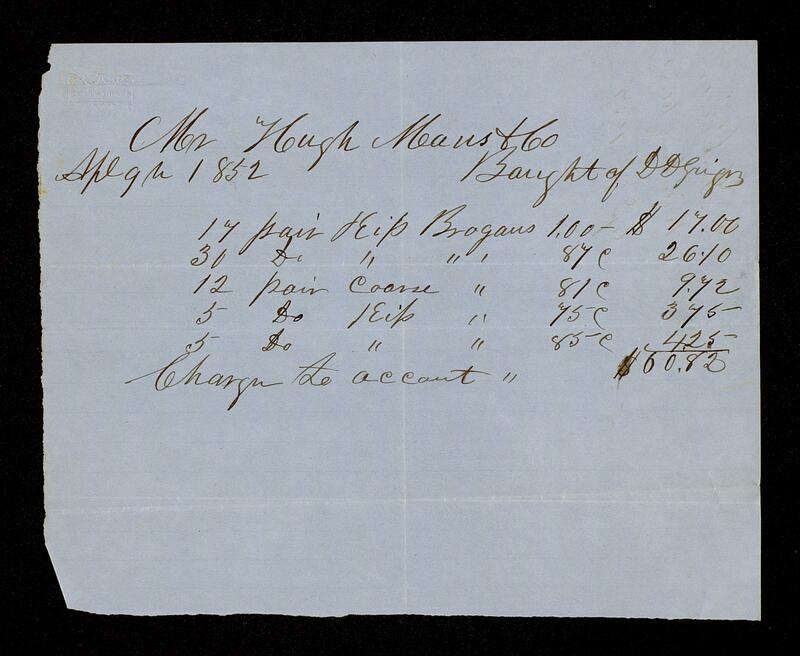 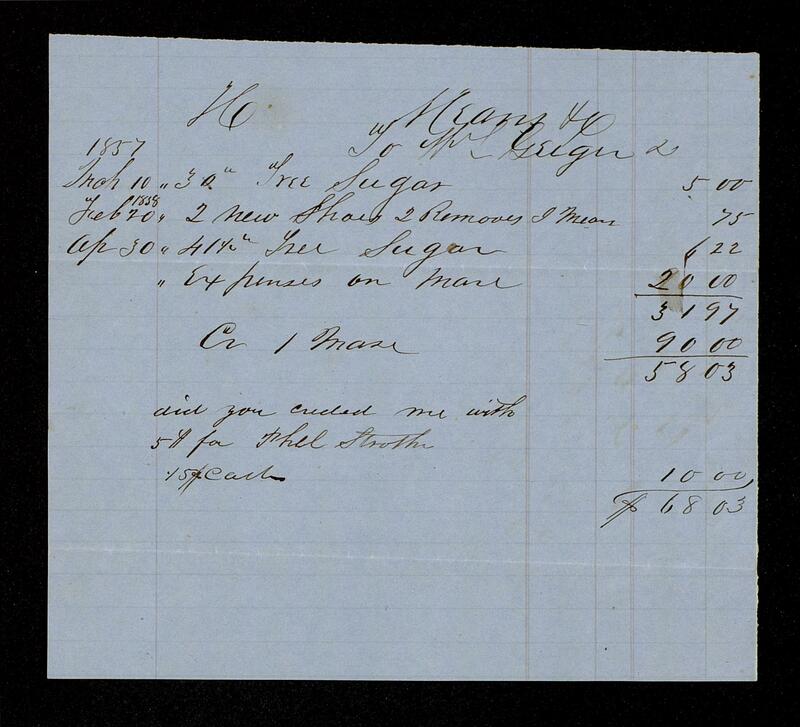 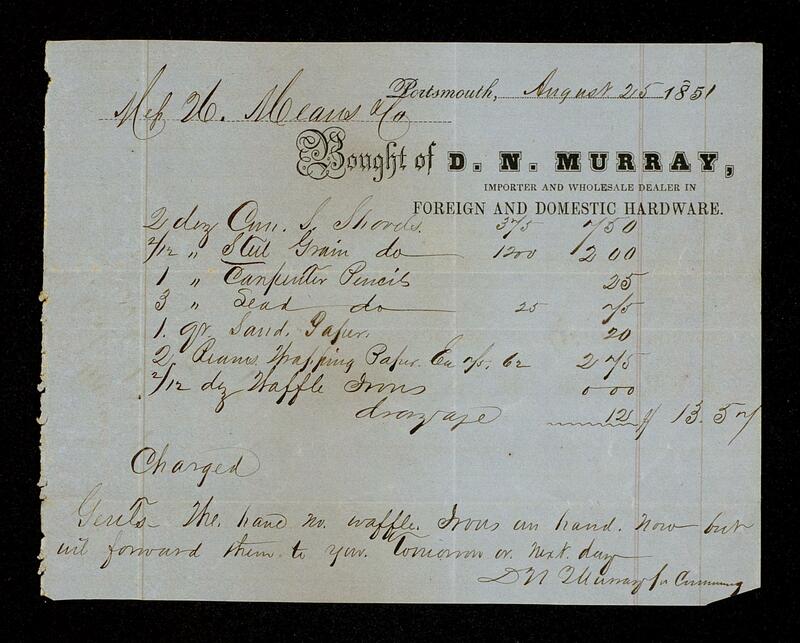 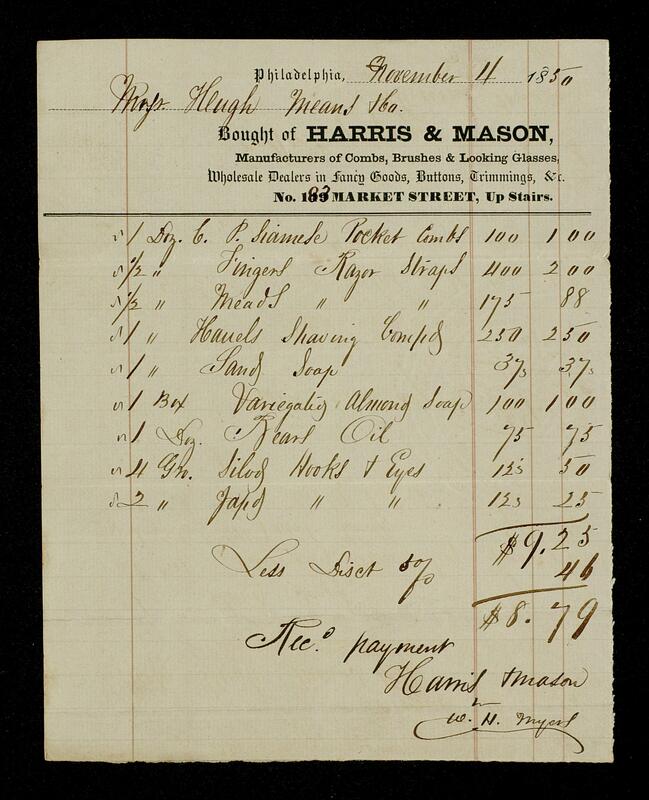 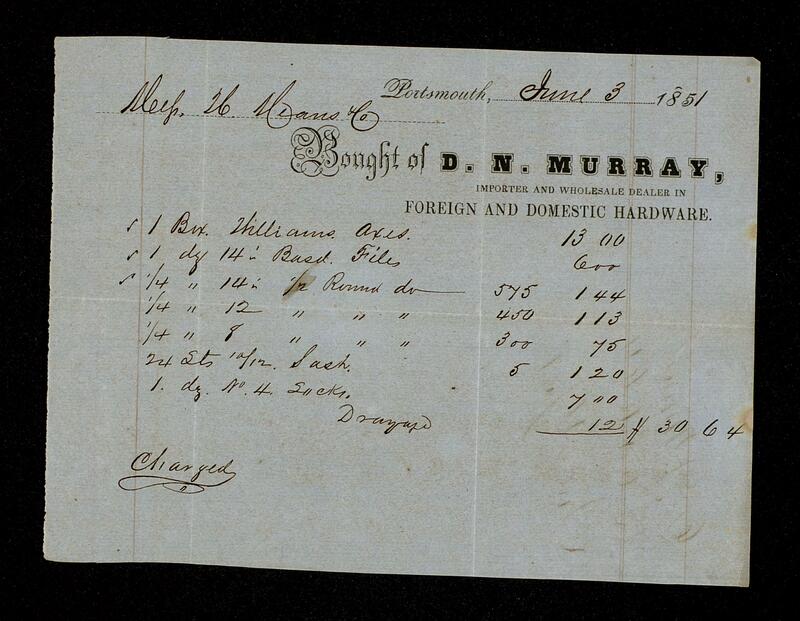 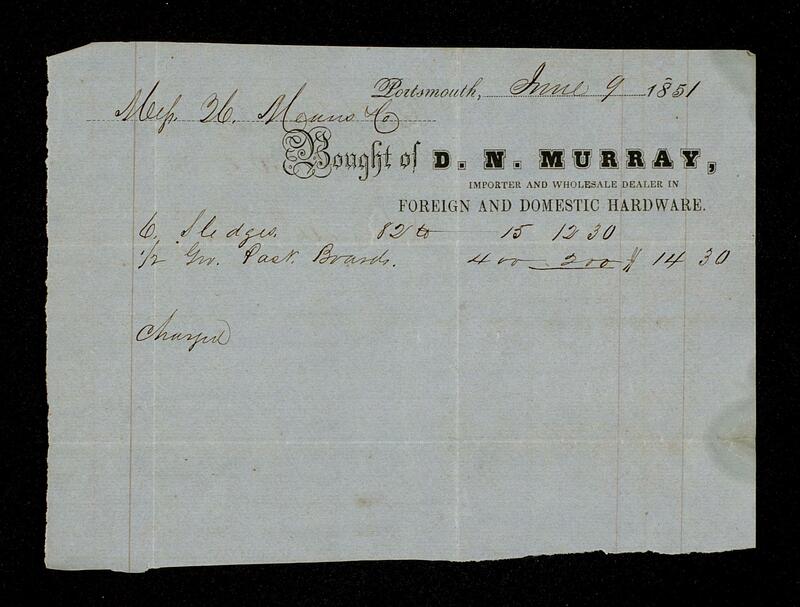 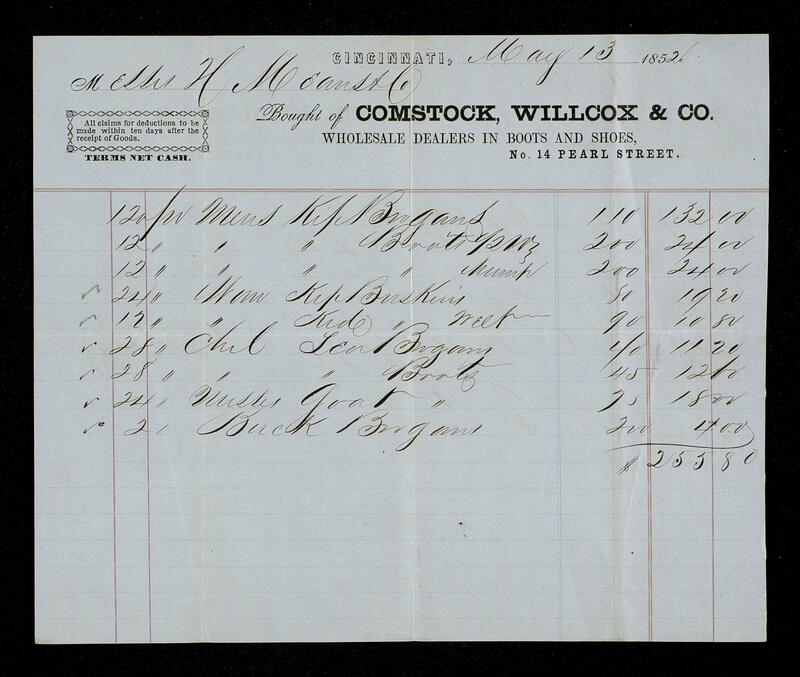 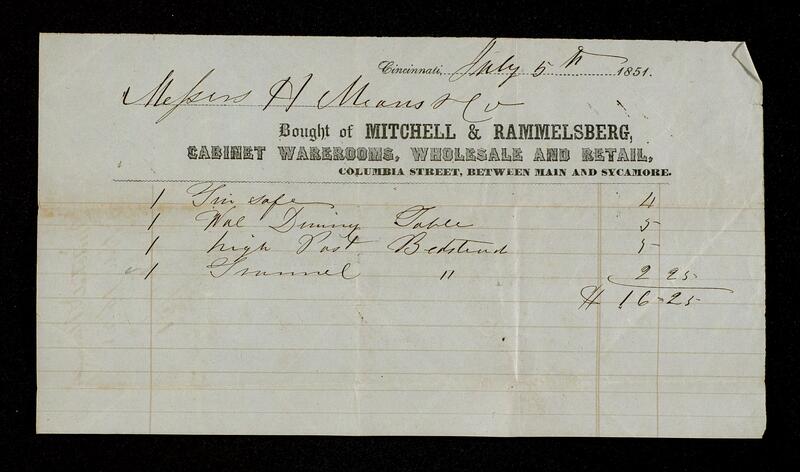 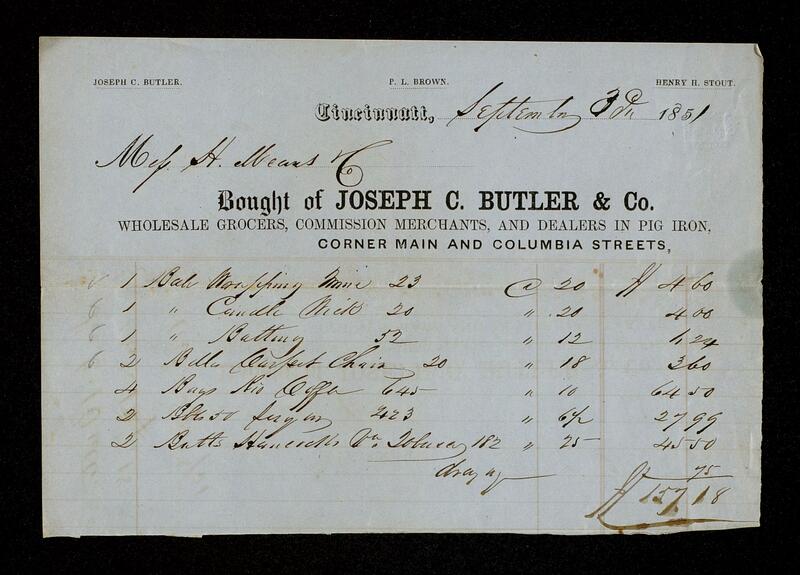 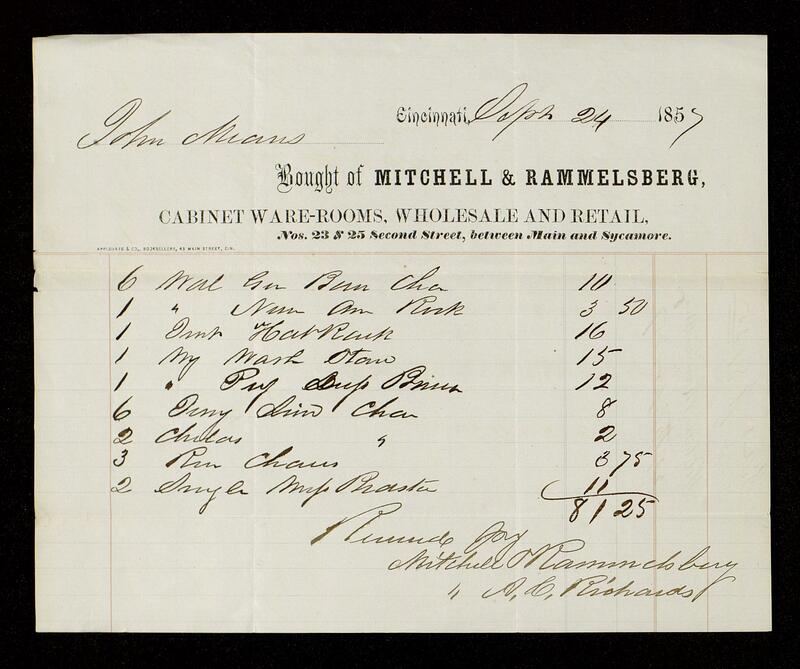 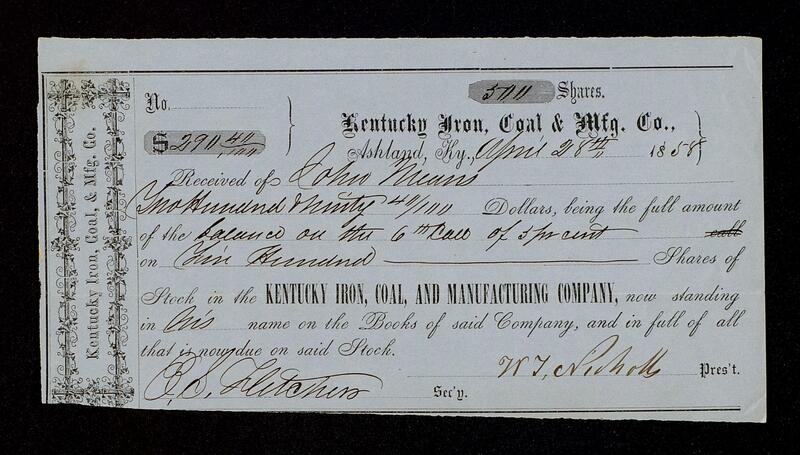 Hugh Means joined his brother Thomas in 1831 at Union Furnace, first as store manager and then assisting in the sale of iron. After spending a short time in Alabama on a merchandizing project, he returned in 1837 to Ohio to settle his father's estate. 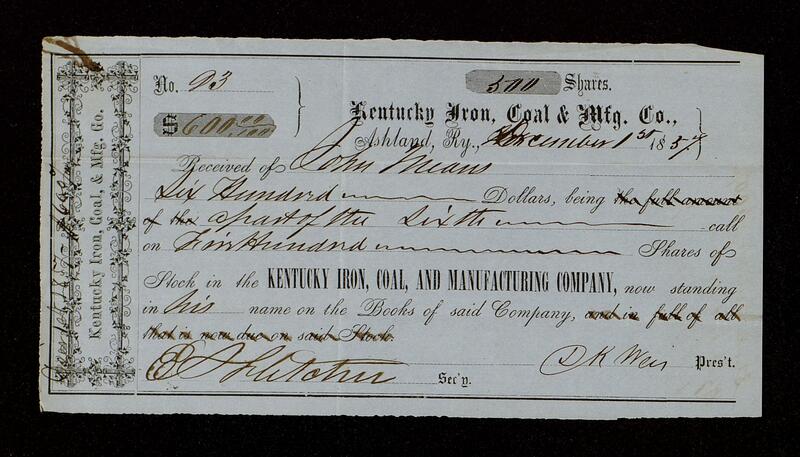 Together with Thomas Means and William Culbertson, he built the Buena Vista Furnace in 1847 in what is now Boyd County, Kentucky. 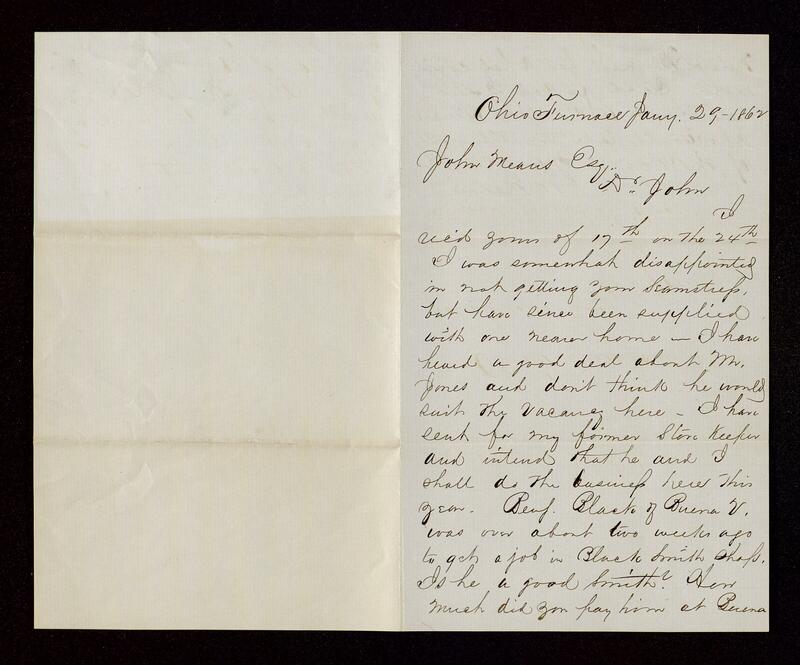 Throughout his life, he maintained a close personal and financial relationship with Thomas and with his nephew John Means. 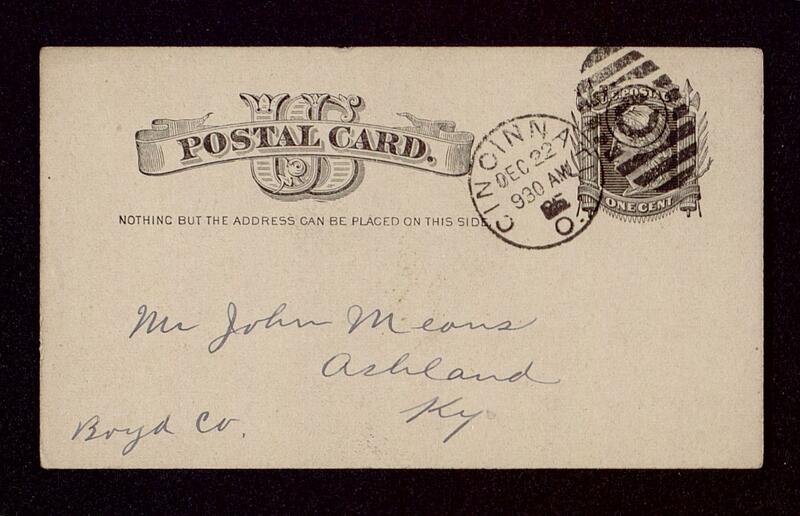 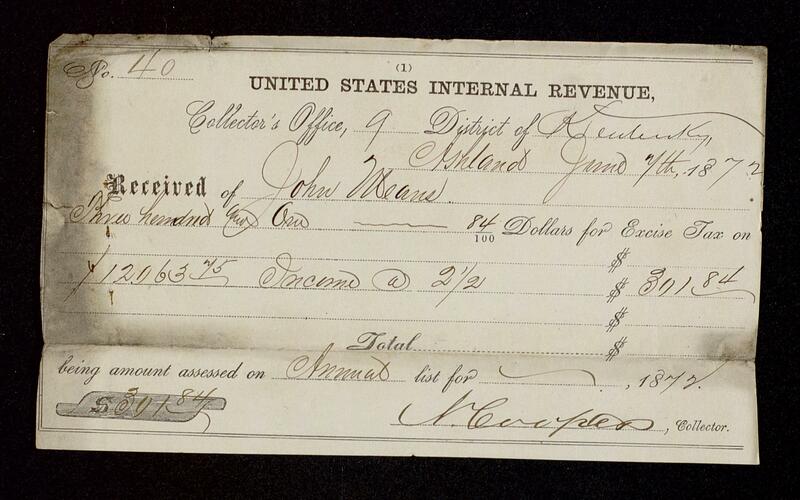 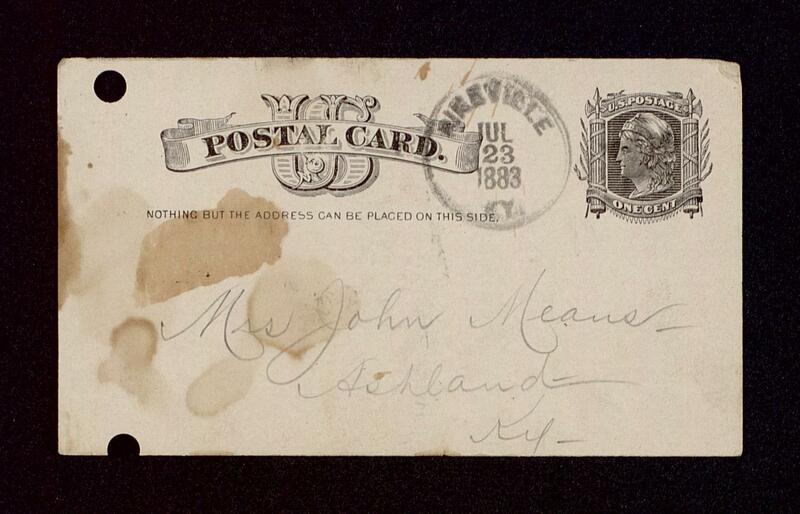 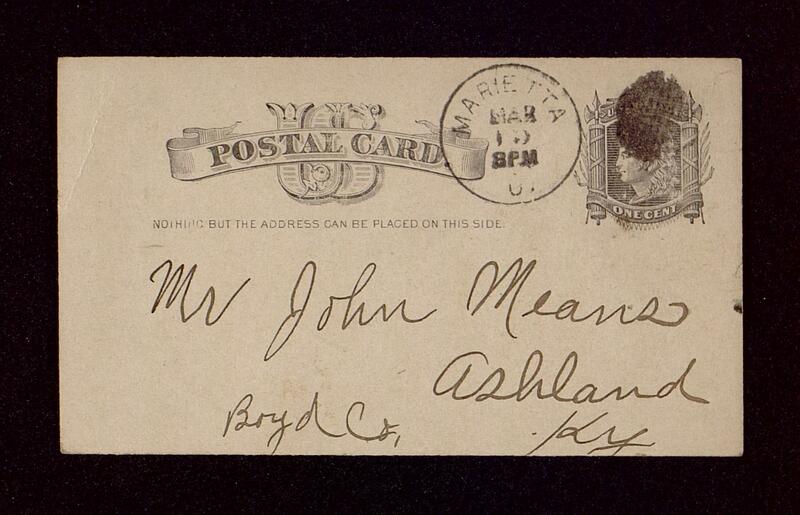 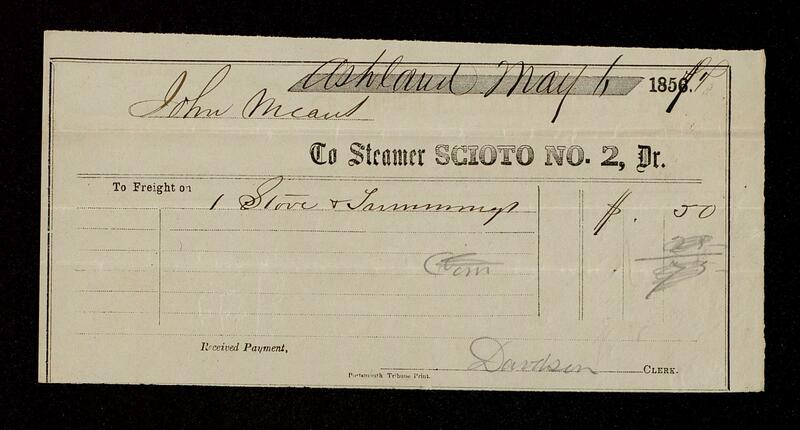 John Means was born at West Union, Adams County, Ohio in 1829. 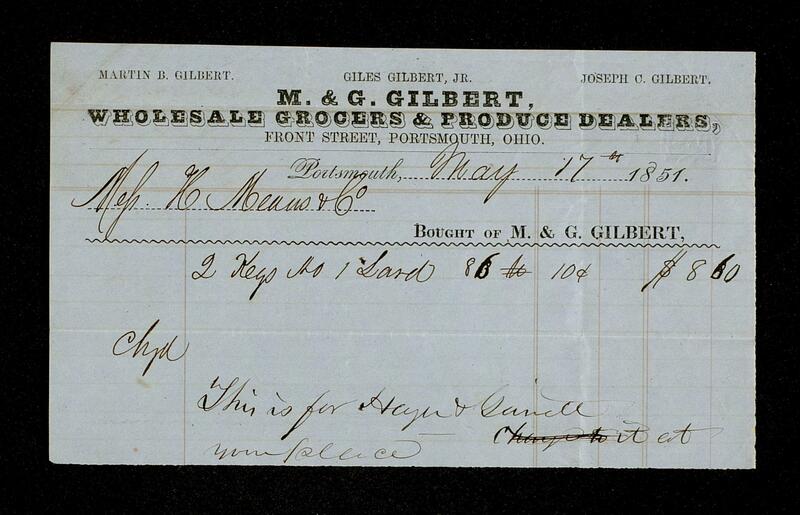 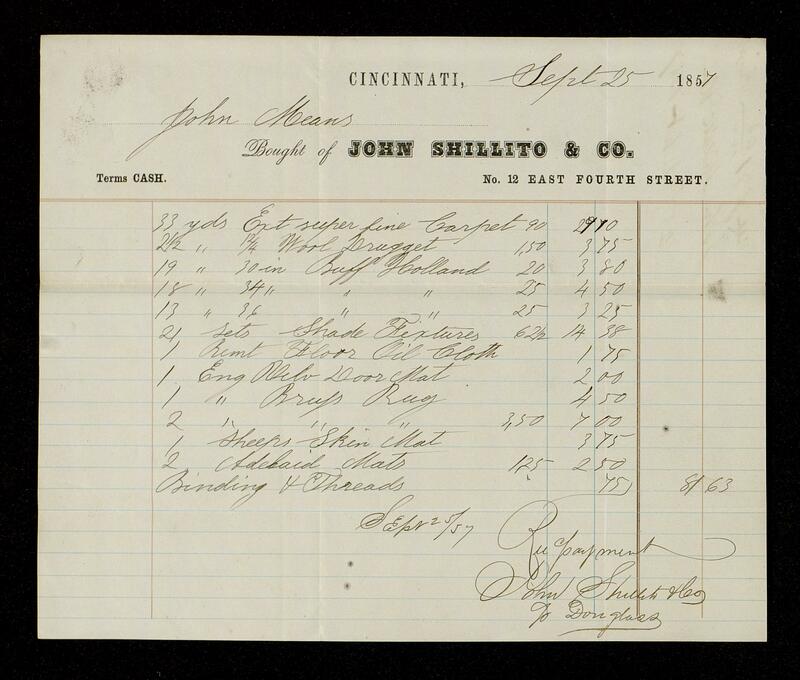 After leaving Marietta College in 1848 because of poor health, he began his apprenticeship as a store keeper at the Ohio Furnace. 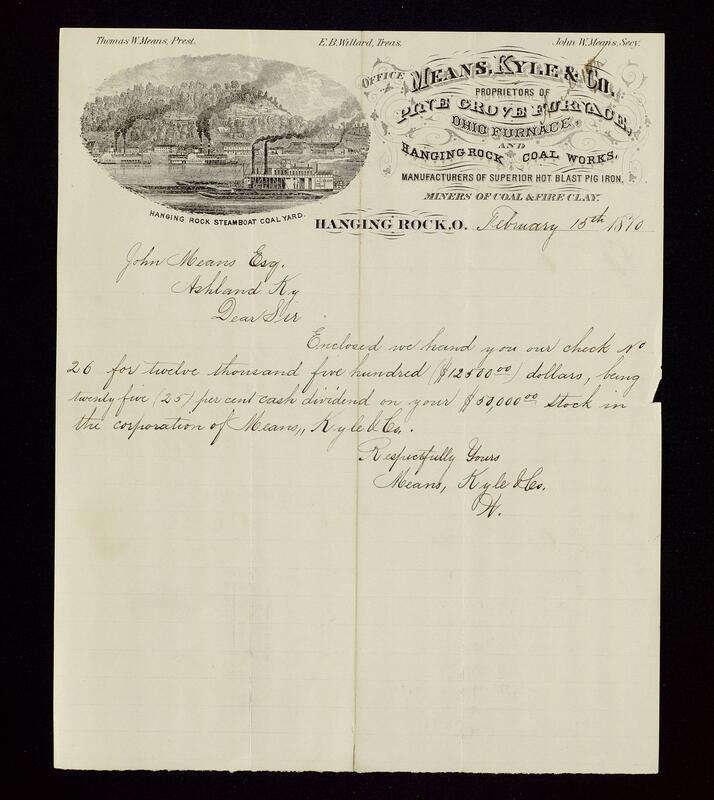 In 1851 he went to Buena Vista Furnace which was then under the control of his father. 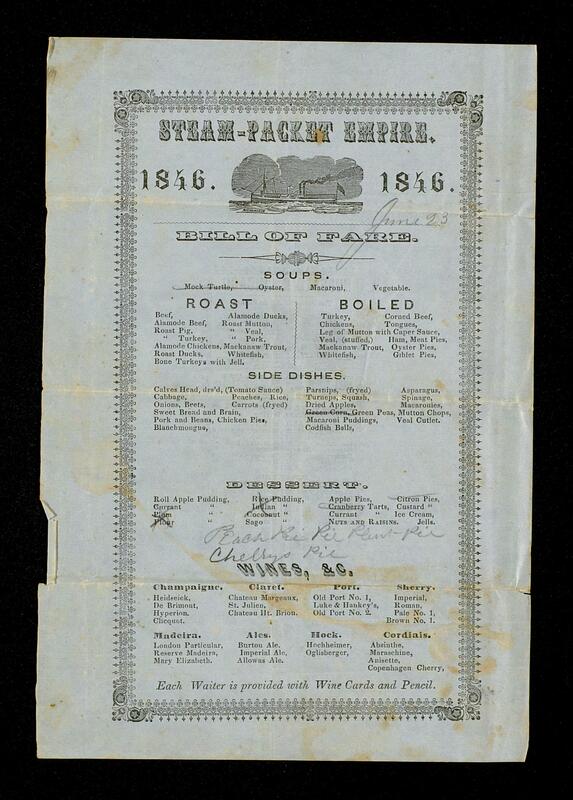 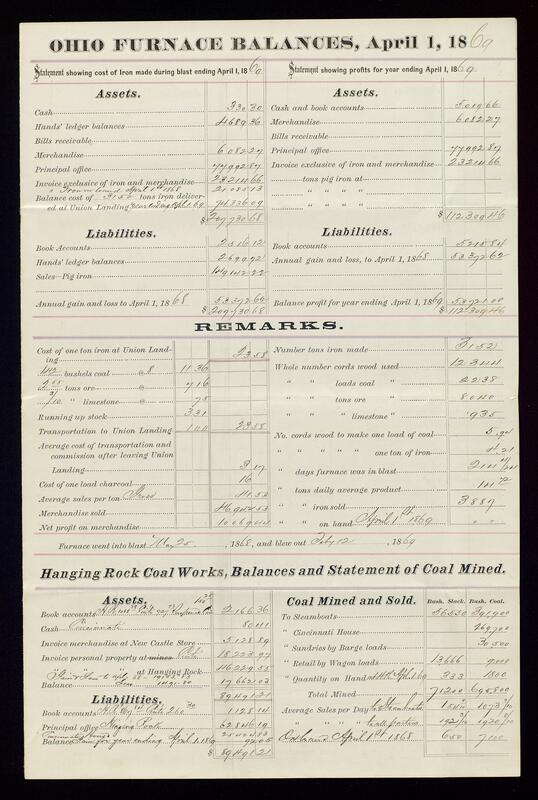 There he served in various capacities until 1861 when the furnace was shut down due to the Civil War. 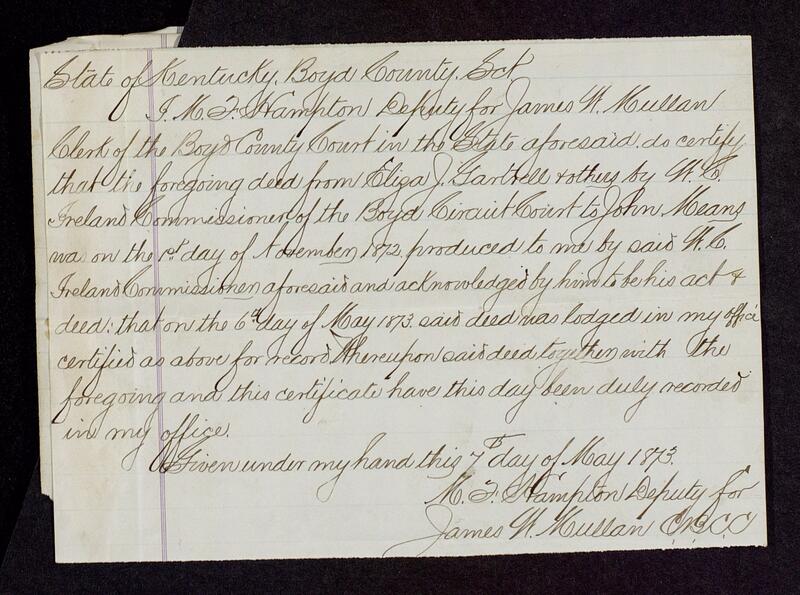 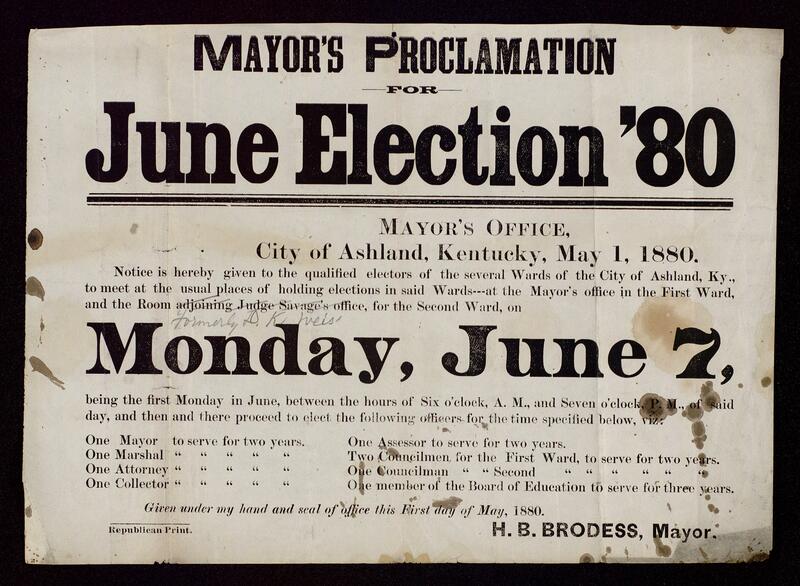 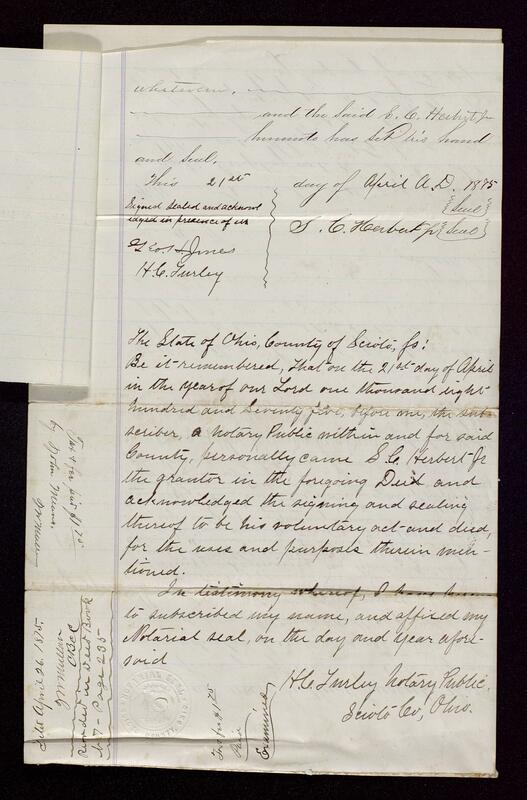 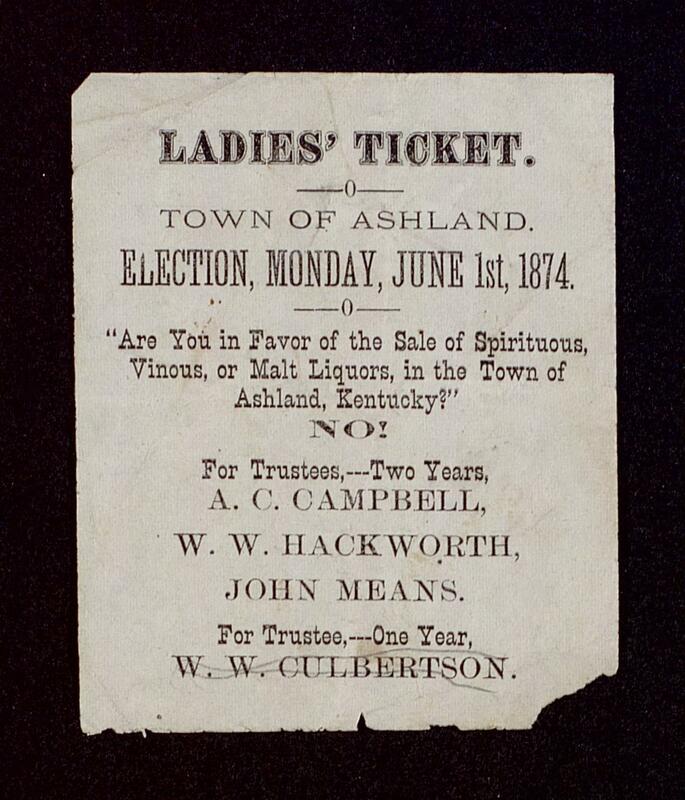 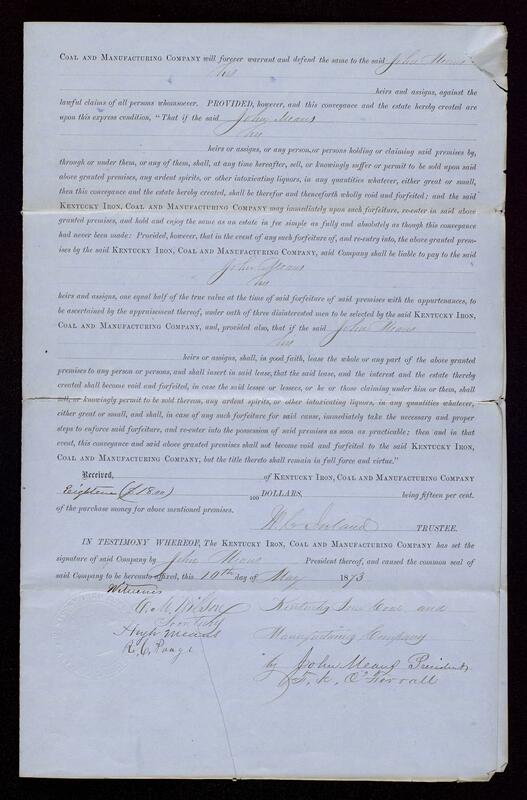 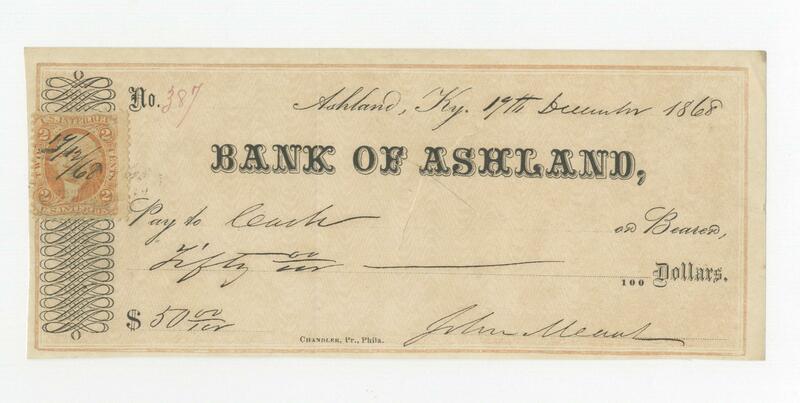 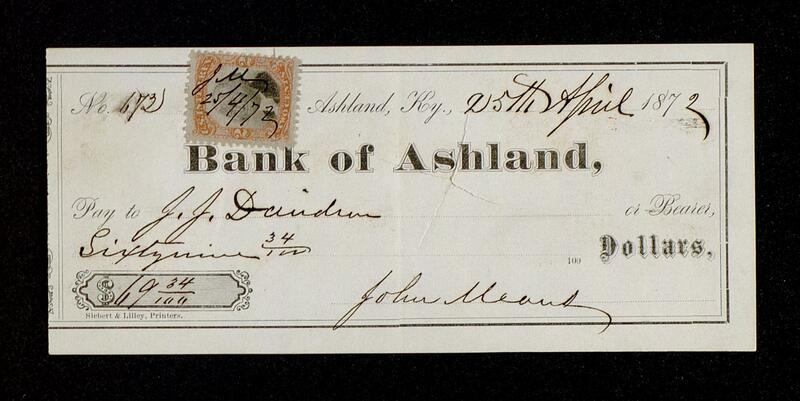 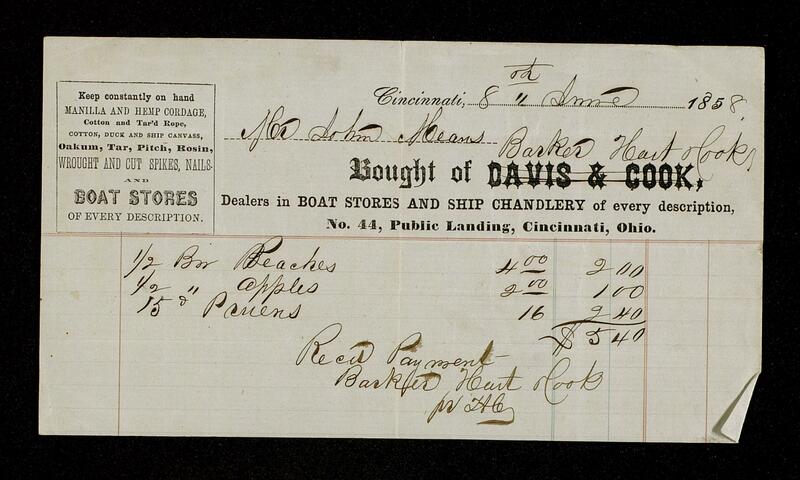 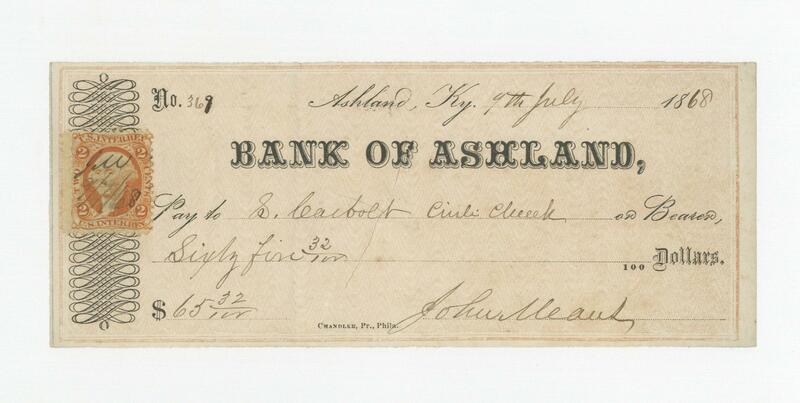 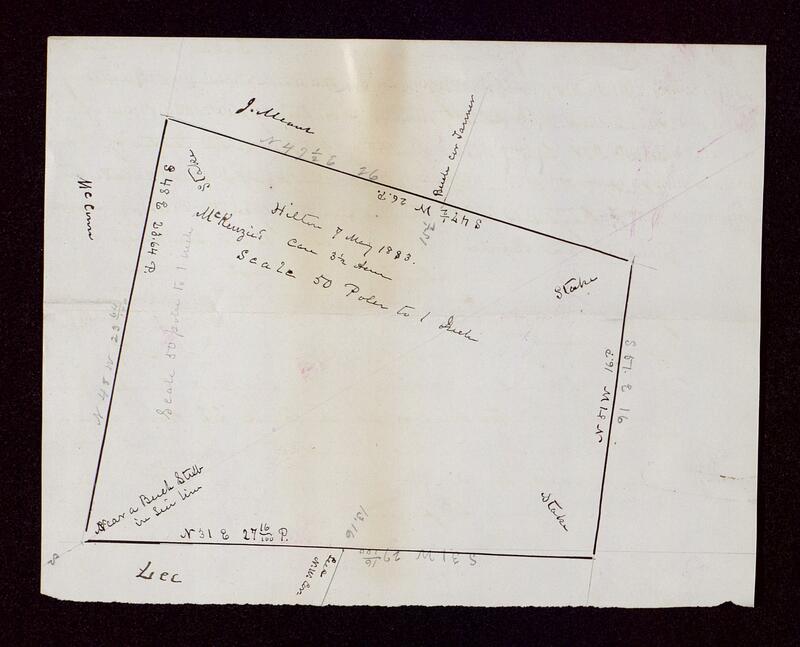 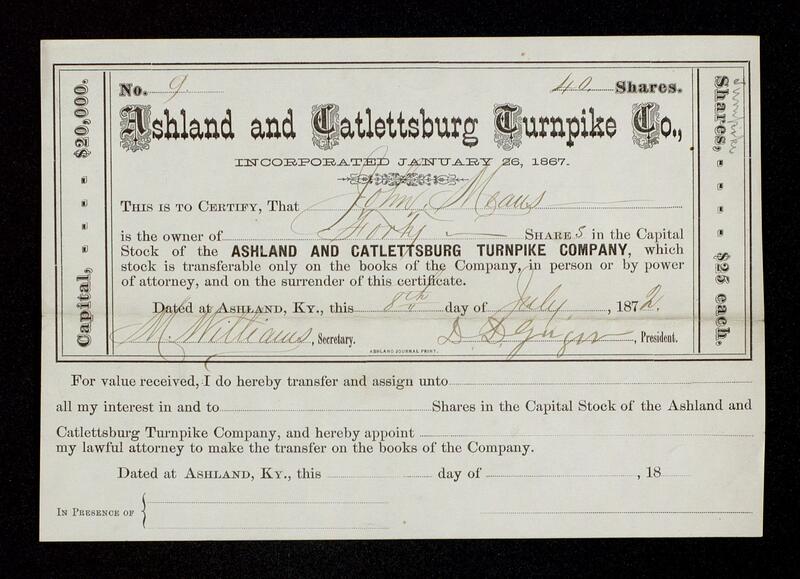 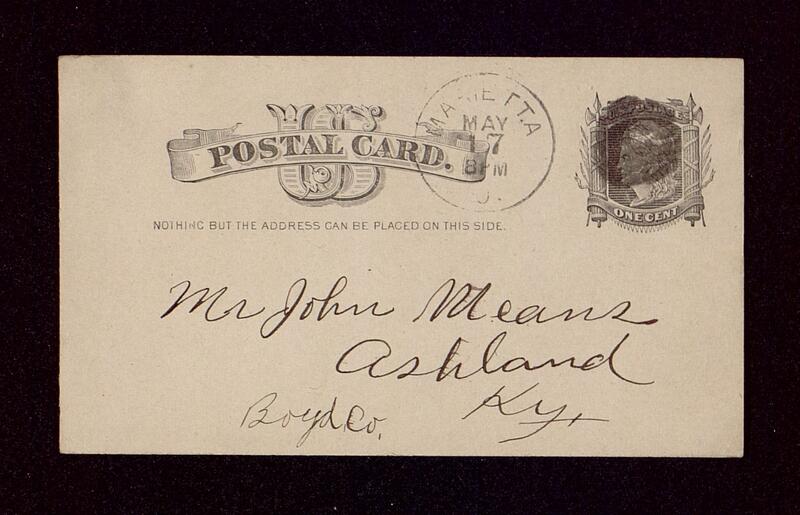 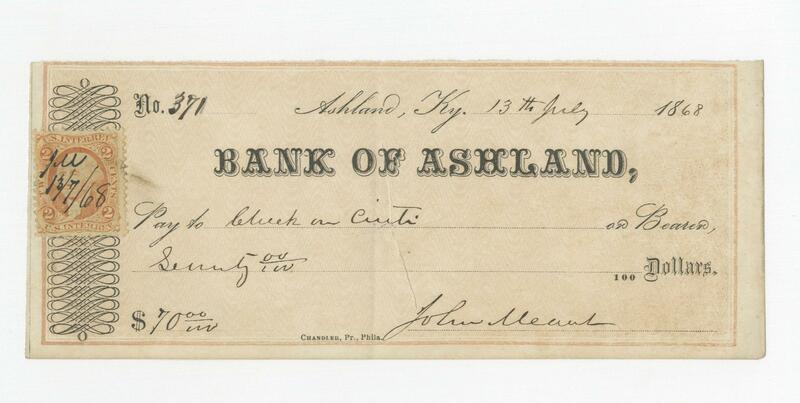 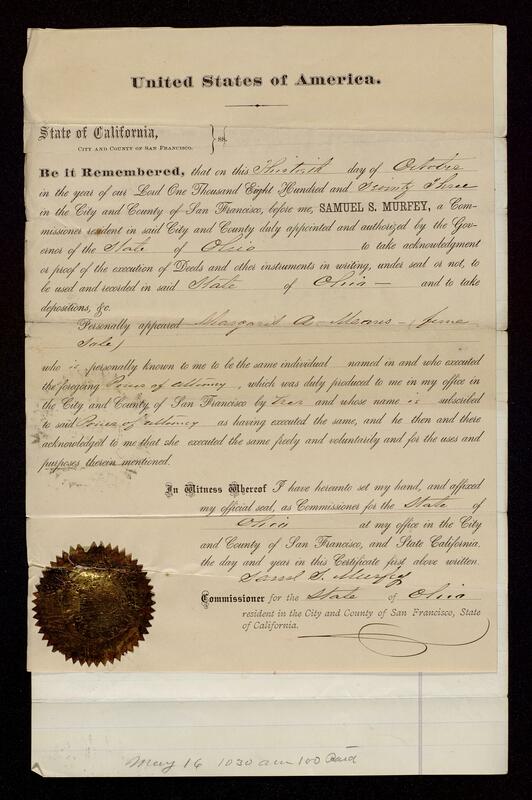 In 1854, acting as his father's agent, he purchased the land upon which the city of Ashland, Kentucky now stands. 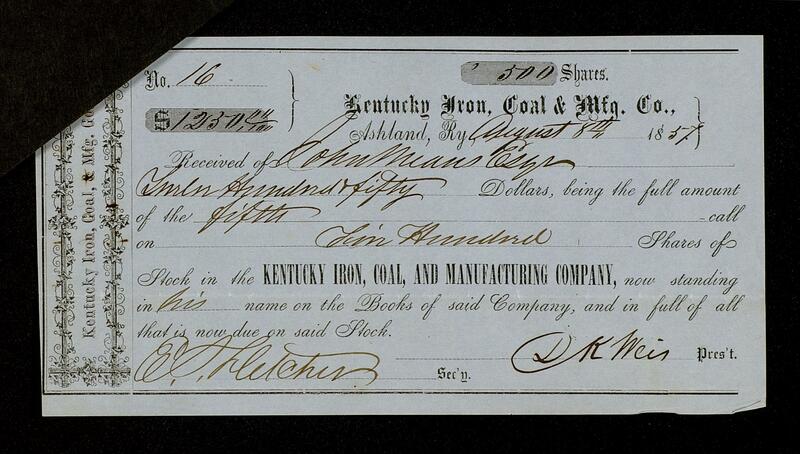 In 1856, John, along with his father Thomas, uncle Hugh, and several other businessmen, formed the Kentucky Iron, Coal and Manufacturing Company to develop the town of Ashland. 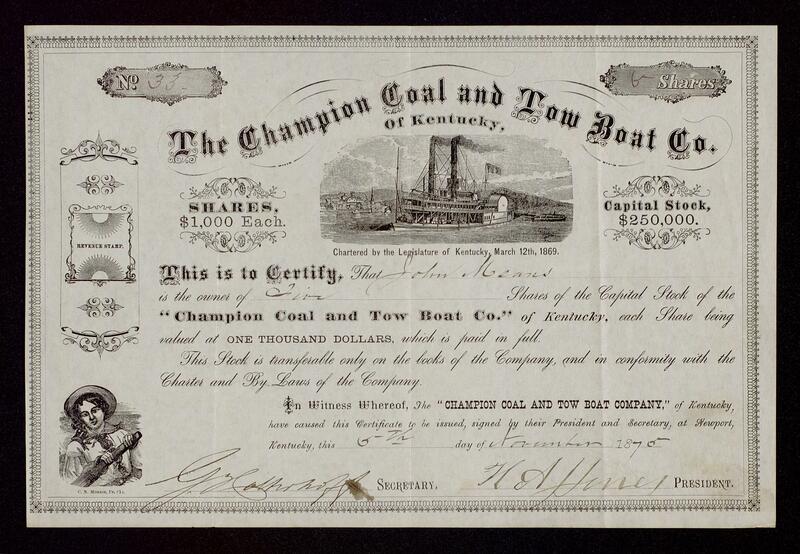 In the same year, the Meanses formed the Cincinnati and Big Sandy Packet Company, a river line made up of big iron freighters. 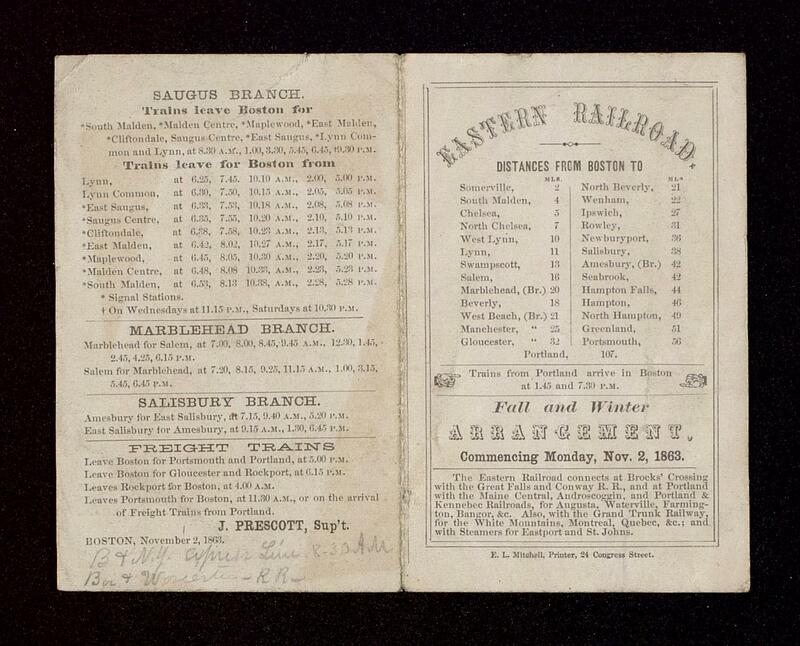 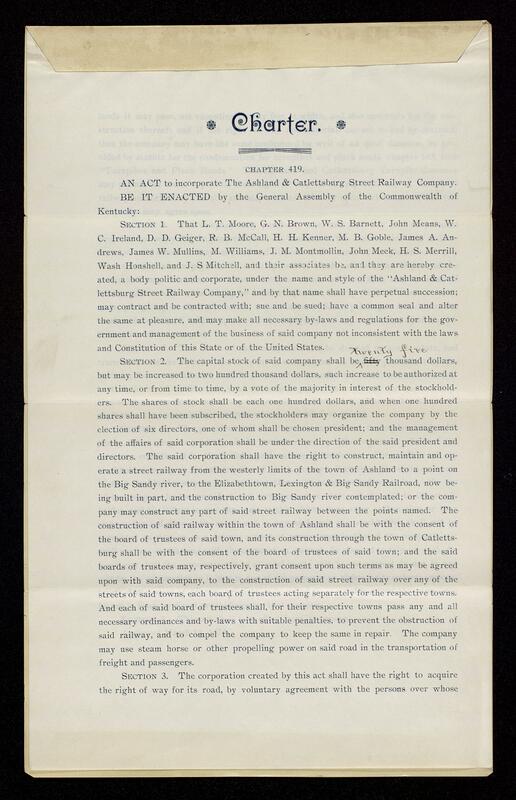 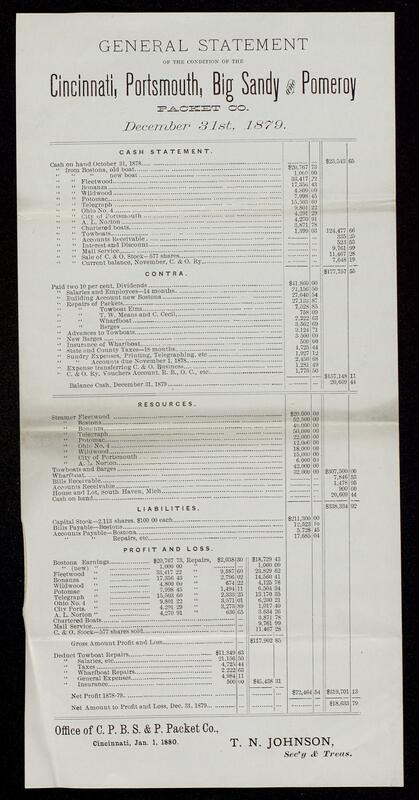 They also bought up the bankrupt eastern division of the Lexington and Big Sandy Railway and, organizing the Ashland Coal and Iron Railway, extended its lines to their vast timber and coal lands to aid in the development of the area. 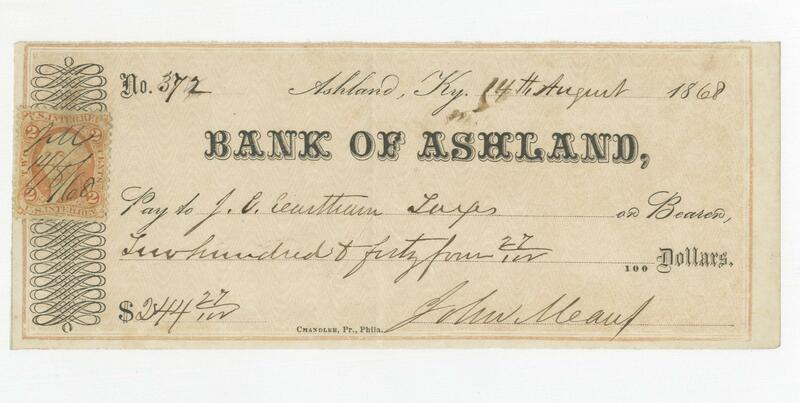 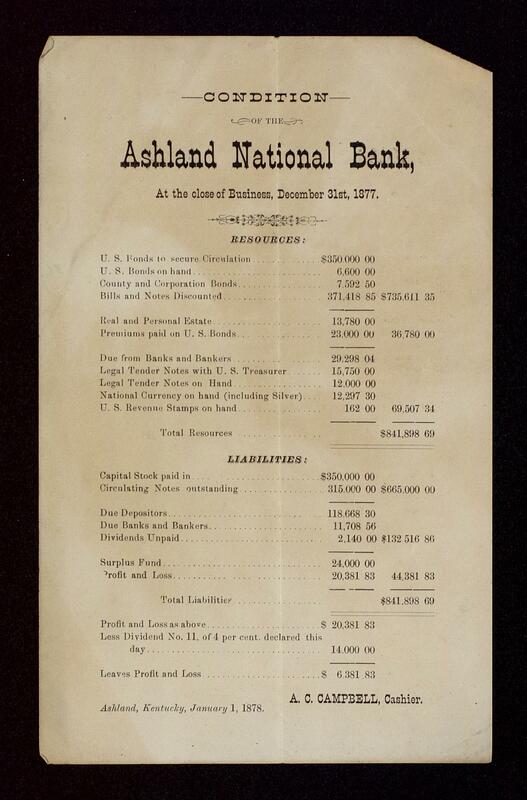 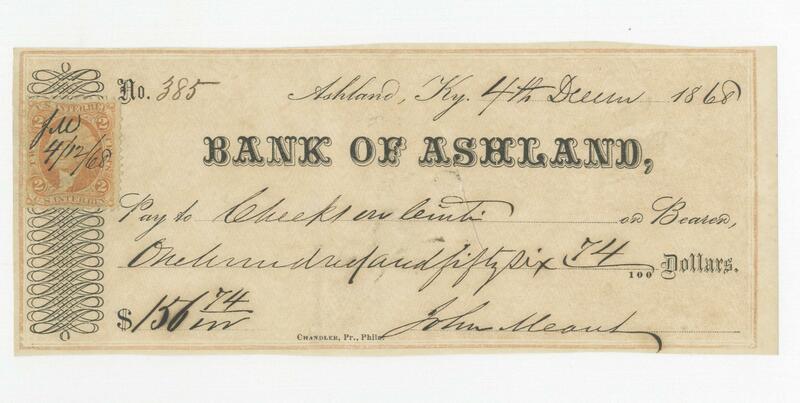 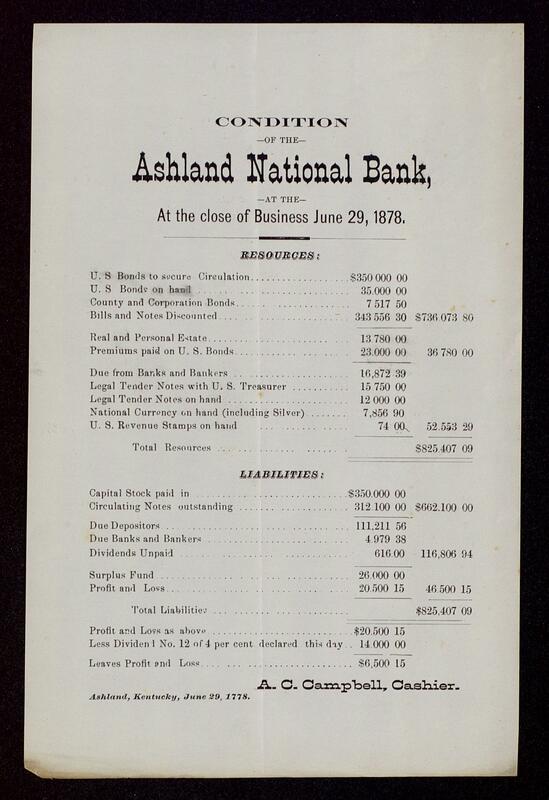 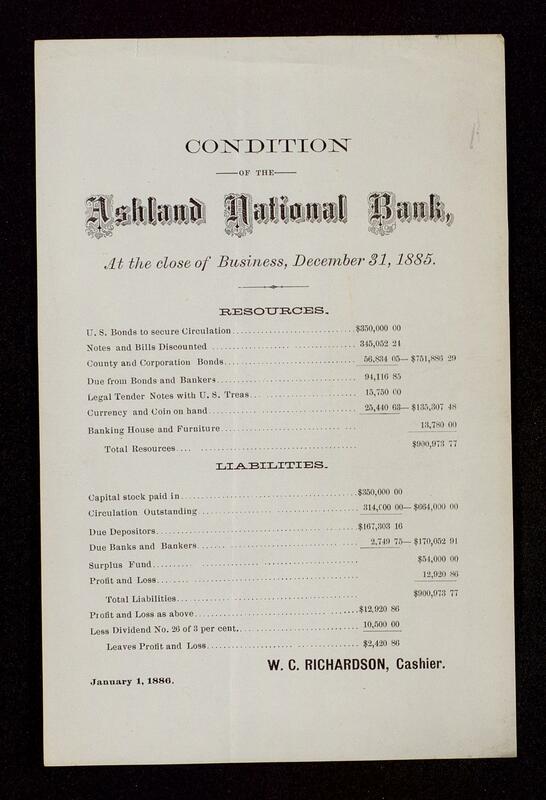 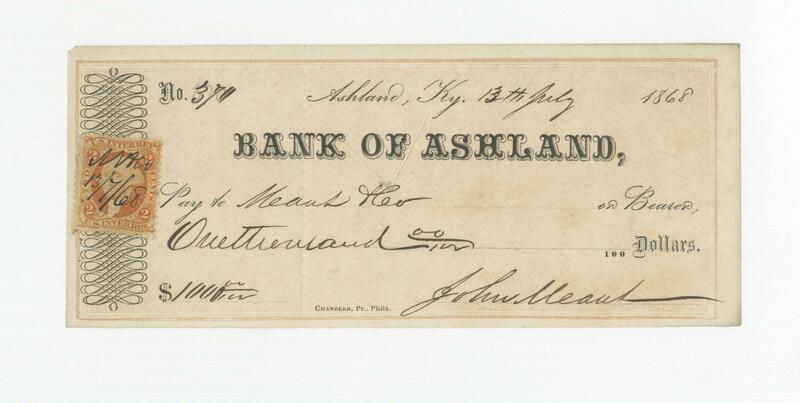 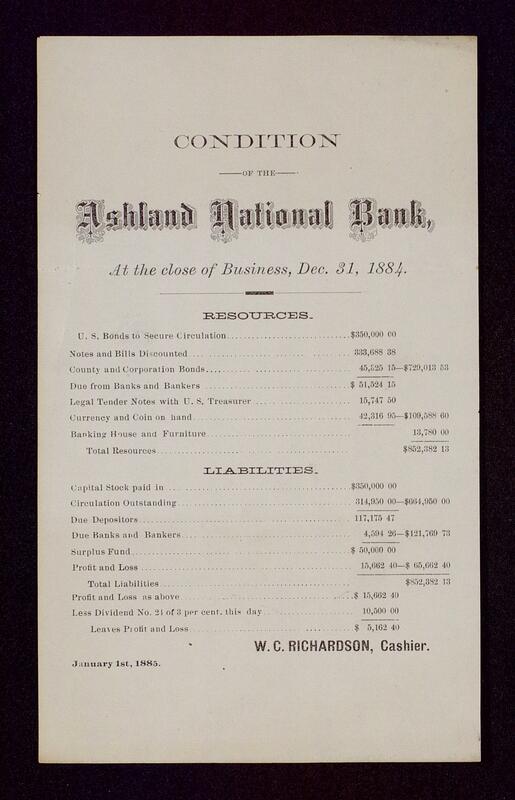 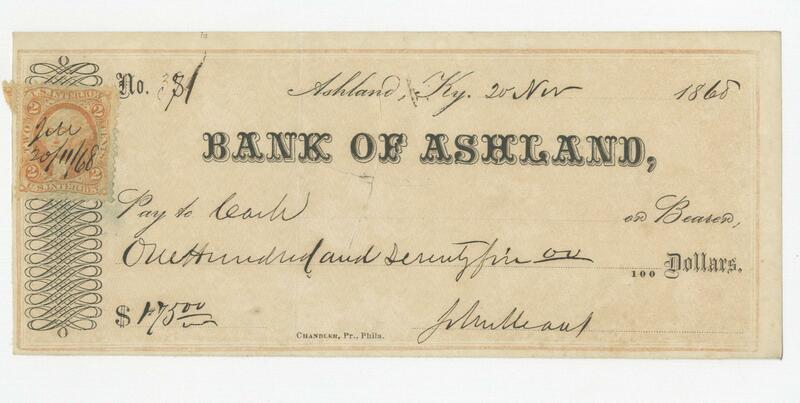 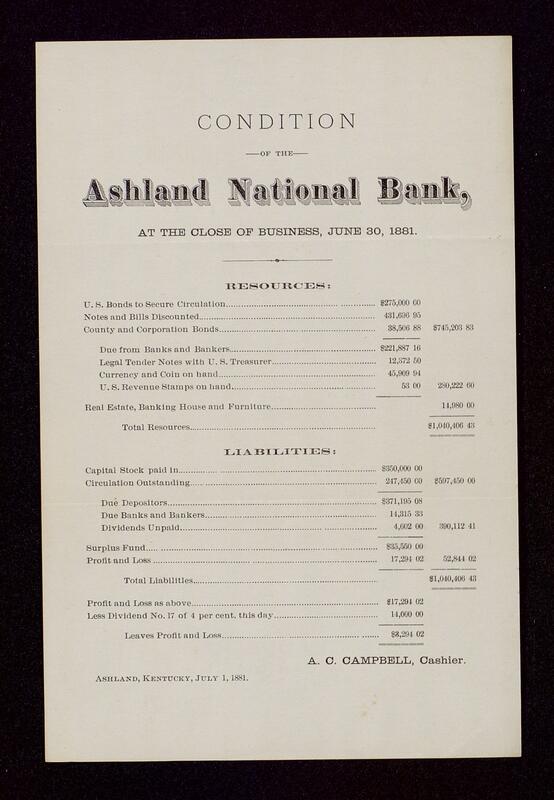 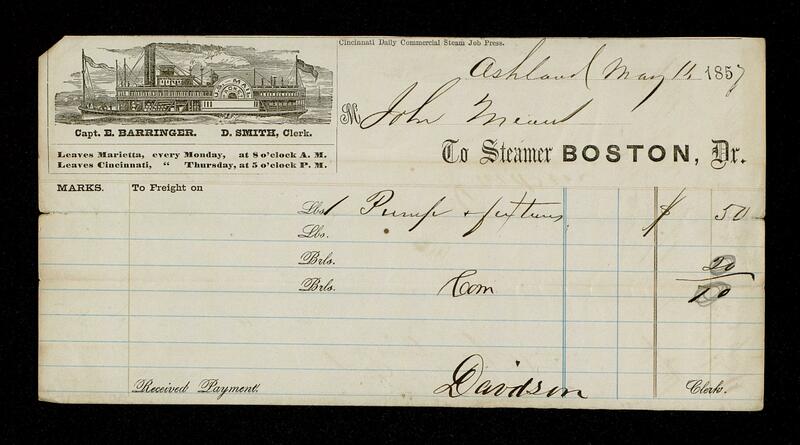 Aside from the role in which the Means family played in the development of the iron industry, the development of transportation, and the establishment of the industrial city of Ashland, they also founded several banking institutions and personally supported various civic and religious organizations. 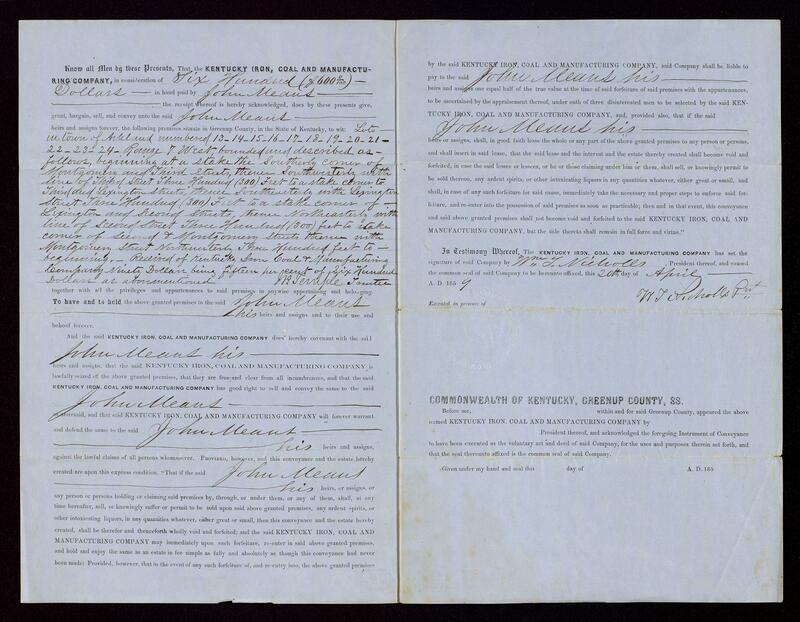 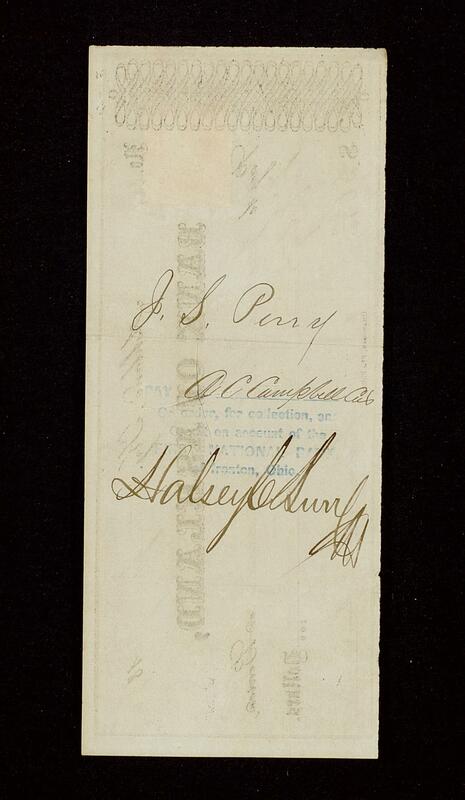 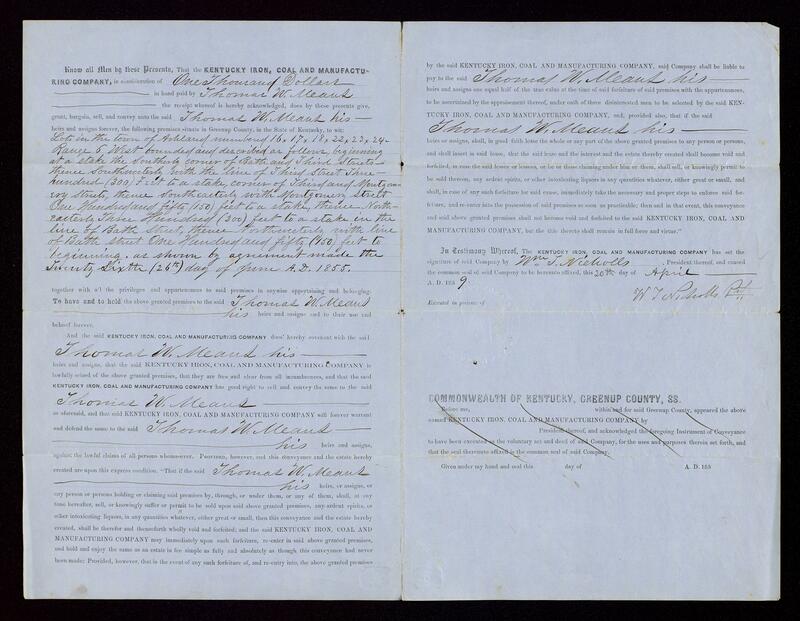 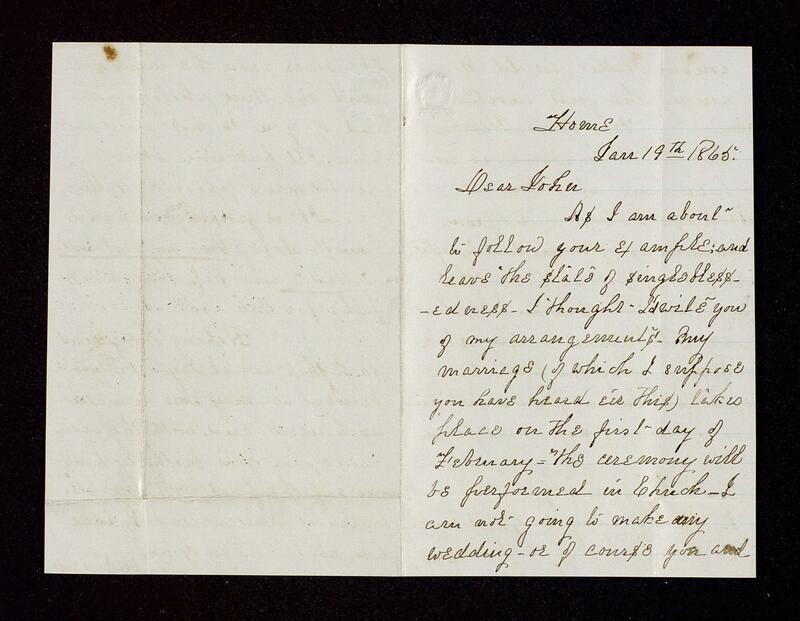 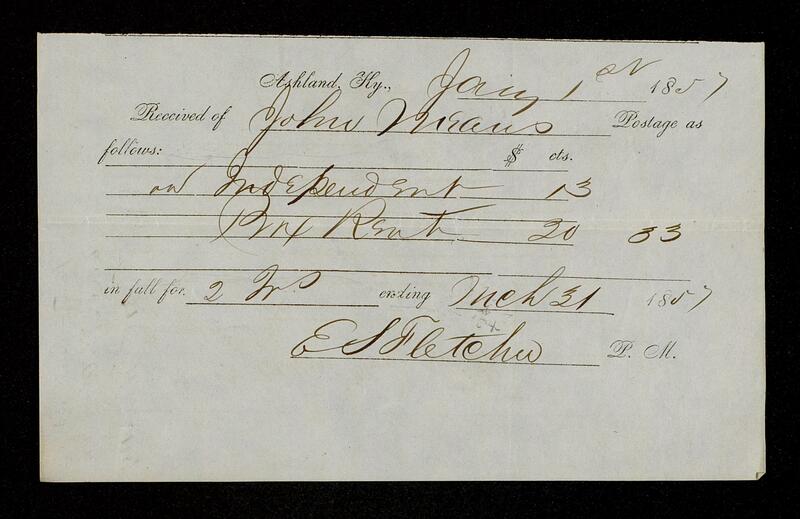 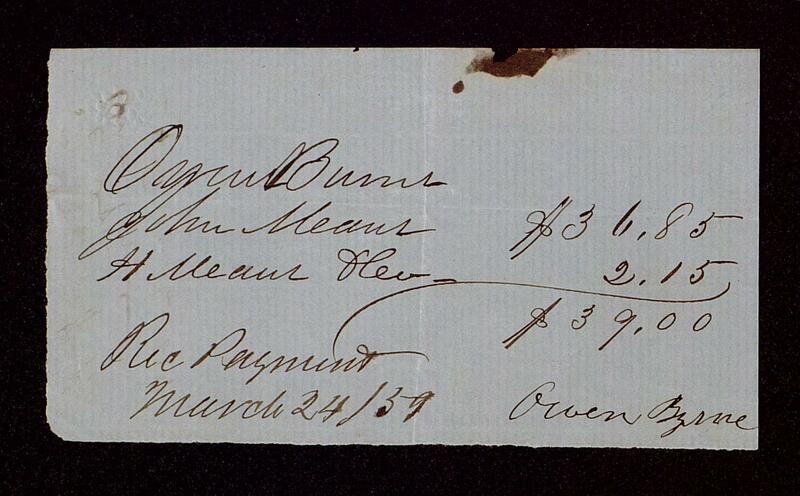 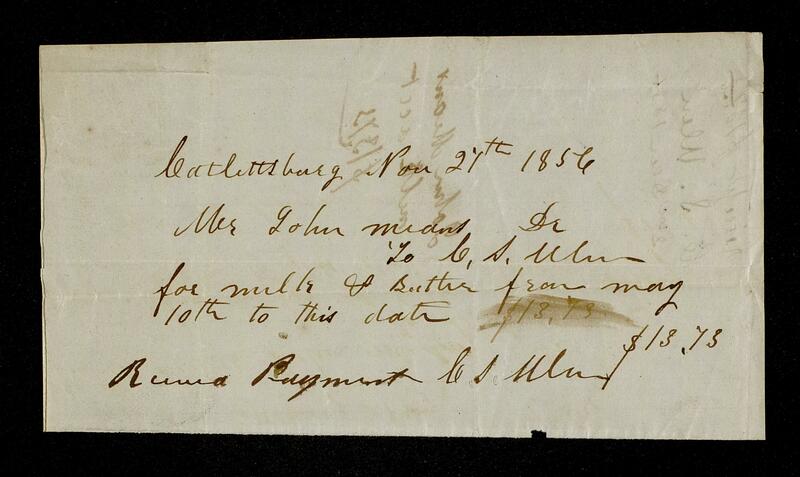 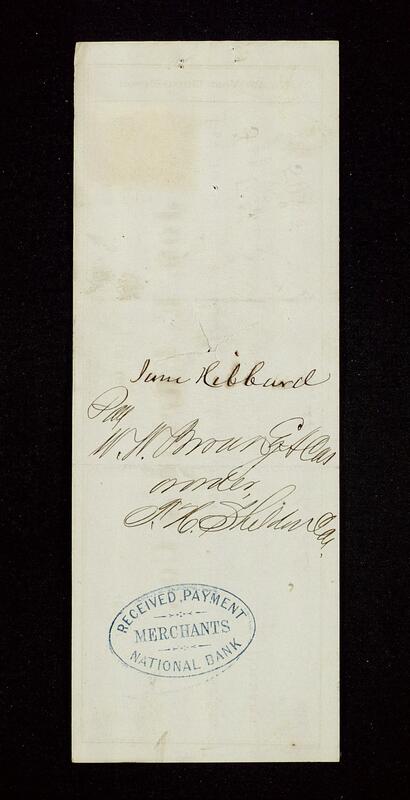 John Means married Mrs. Harriet Hildreth Perkins on October 25, 1854. She was the daughter of Dr. Samuel Prescott Hildreth, of Marietta, Ohio, a member of the state legislature, assistant State Geologist, and local historian. 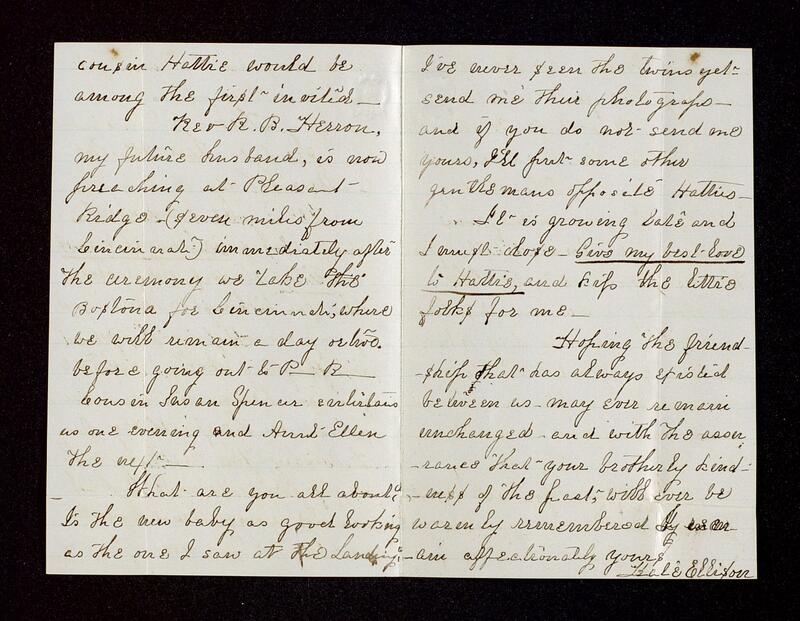 Together, John and Harriet had six children: Thomas Hildreth, Eliza Isabella, Lillian, Rosalie, Harold, and Ellison Cooke (E.C.). Inheriting a vast industrial and financial empire from his father, E.C. 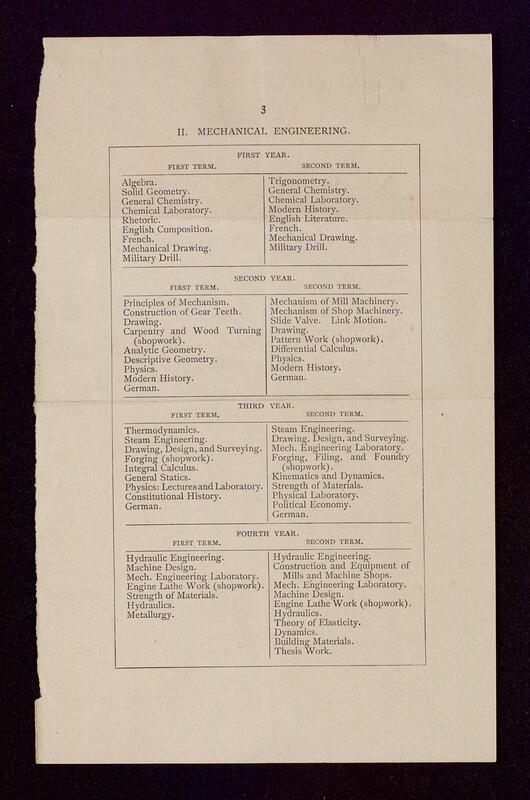 Means, after attending Marietta College andthe Massachusetts Institute of Technology, graduating from the latter in 1887. 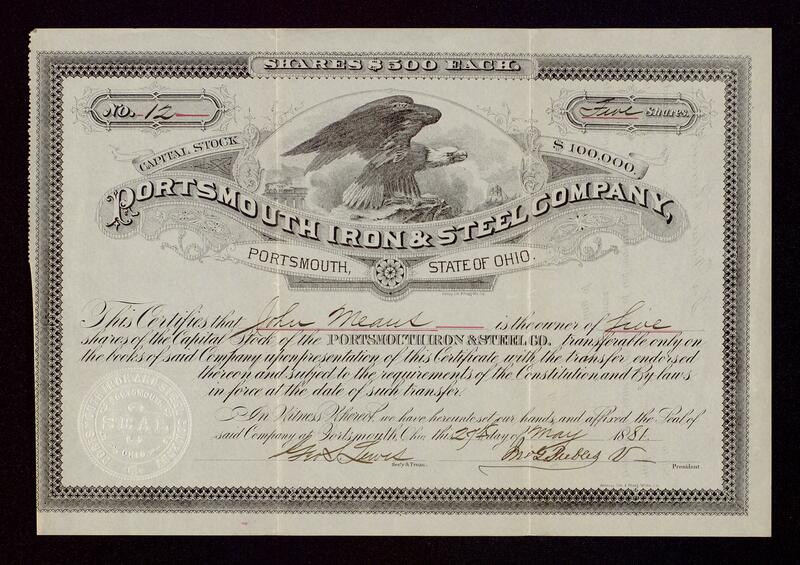 He began his career as assistant to the manager of the Low Moor Iron Company which his father had helped form in 1873 in western Virginia. 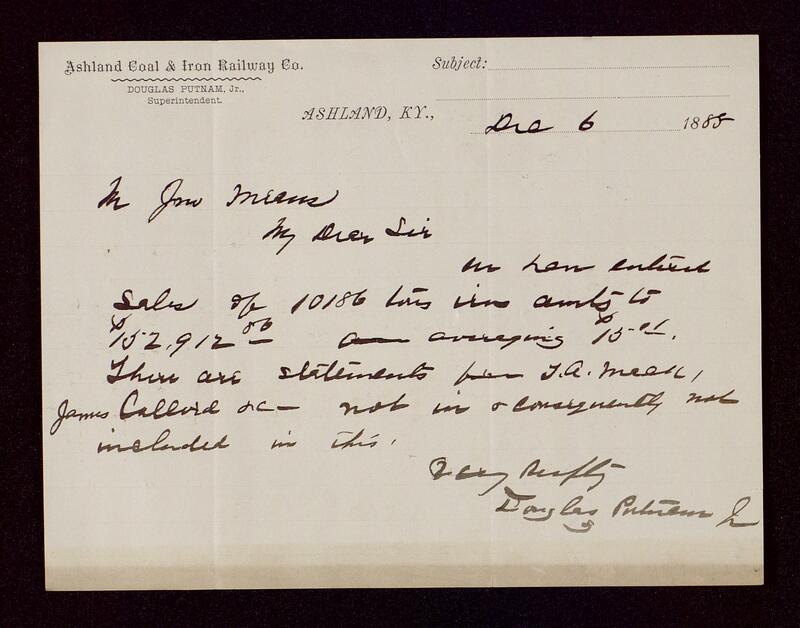 He also served as superintendent of the Ashland Coal and Iron Railway from 1891 to 1901, when he then became general manager of Low Moor. 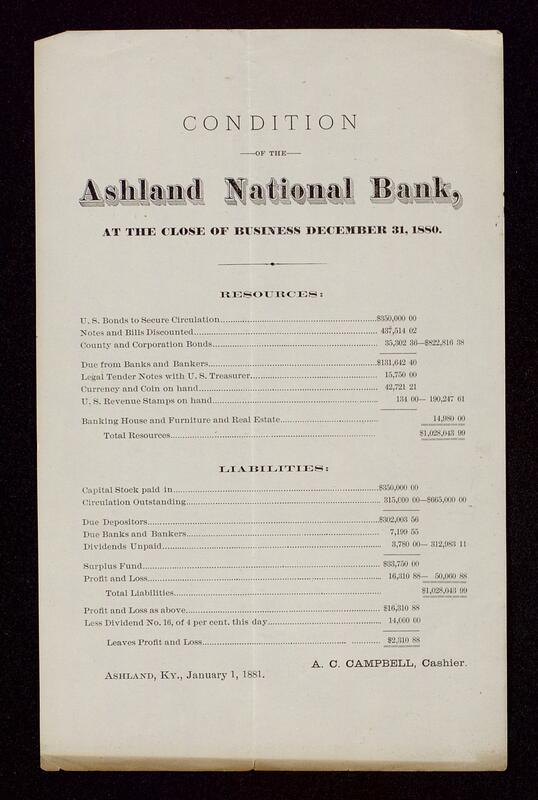 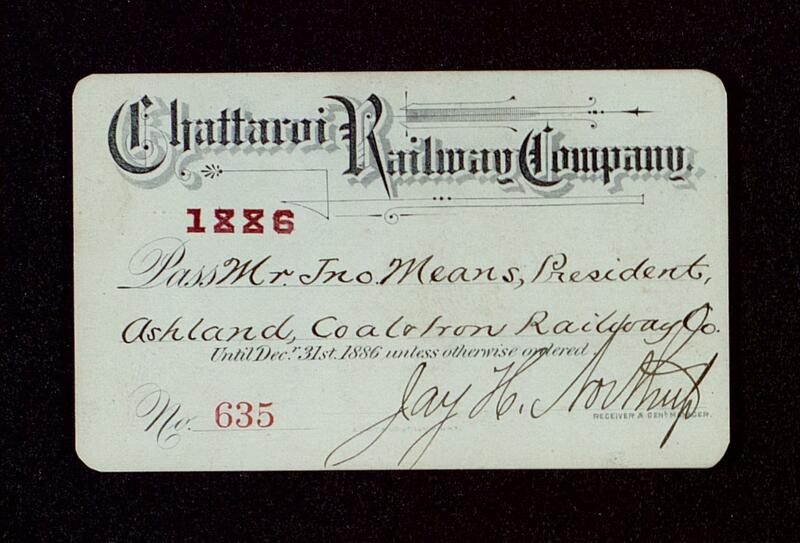 In 1916 he returned to Ashland to accept the position of president of the Means Realty Company. He also held various executive positions with the Yellowstone Poplar Lumber Company, the Ashland Steel Company, Norton Iron Works, and the Clinton Fire Brick Works. 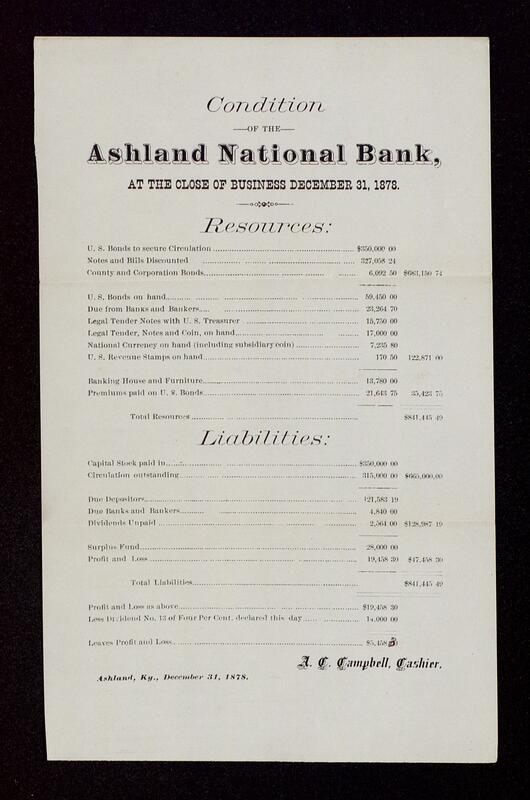 Aside from his business associations, Means was also active in civic affairs of the community, the Chamber of Commerce, the Rotary Club, and served as chairman of the Ashland Water Works from 1921-1931. 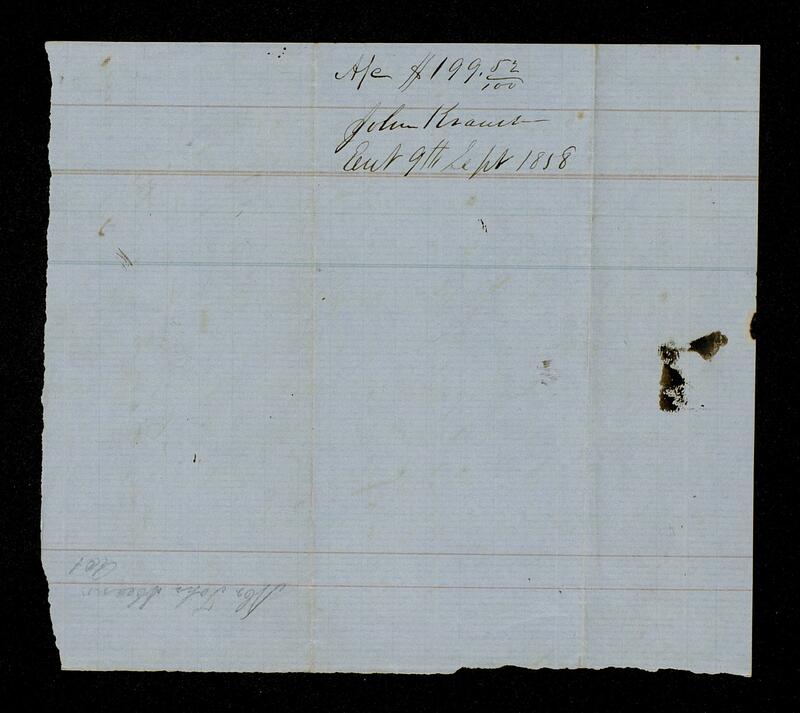 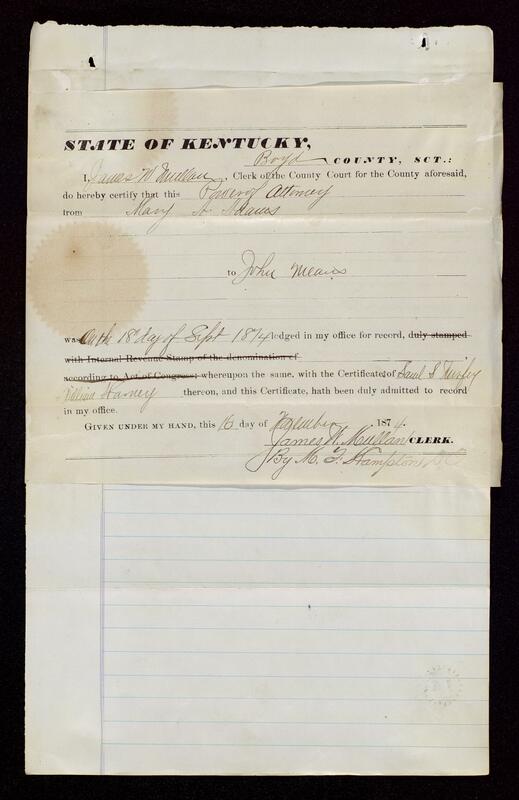 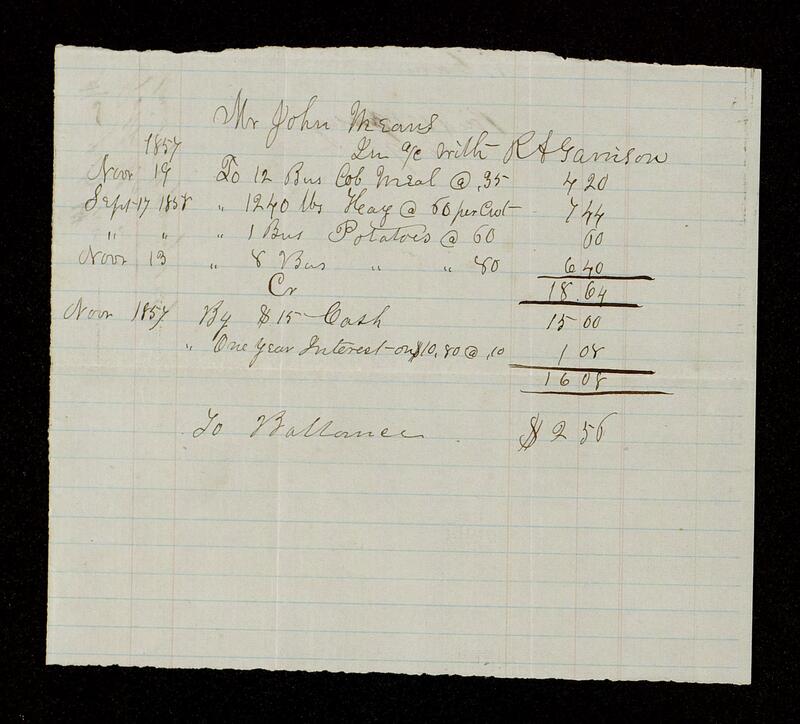 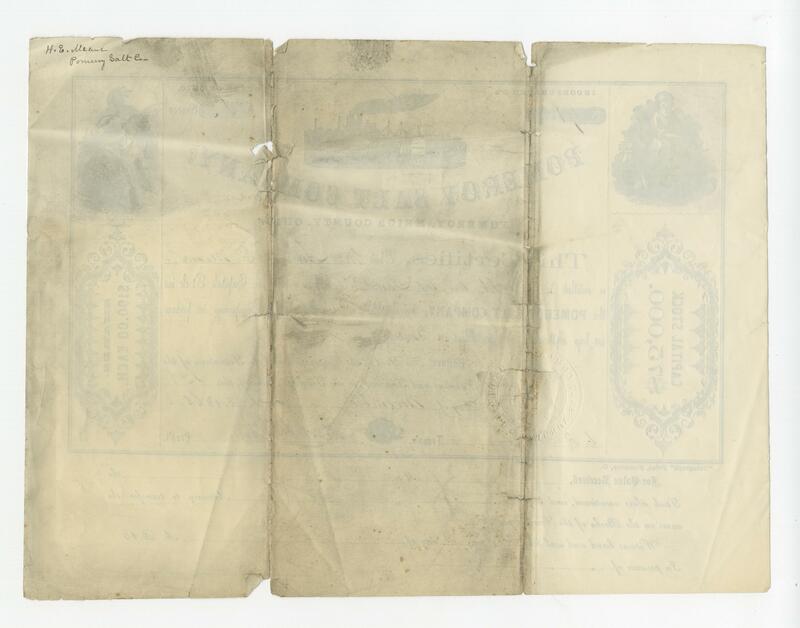 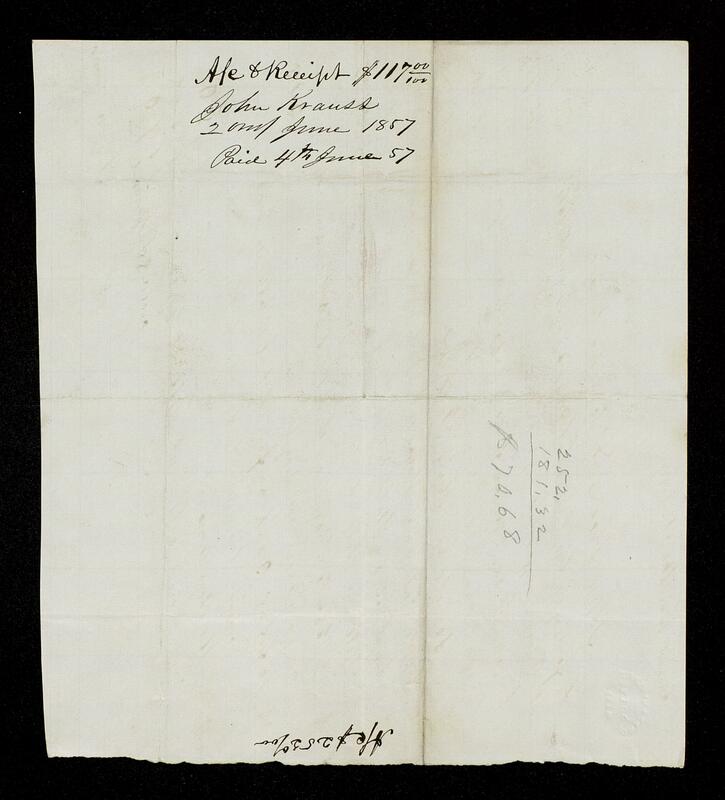 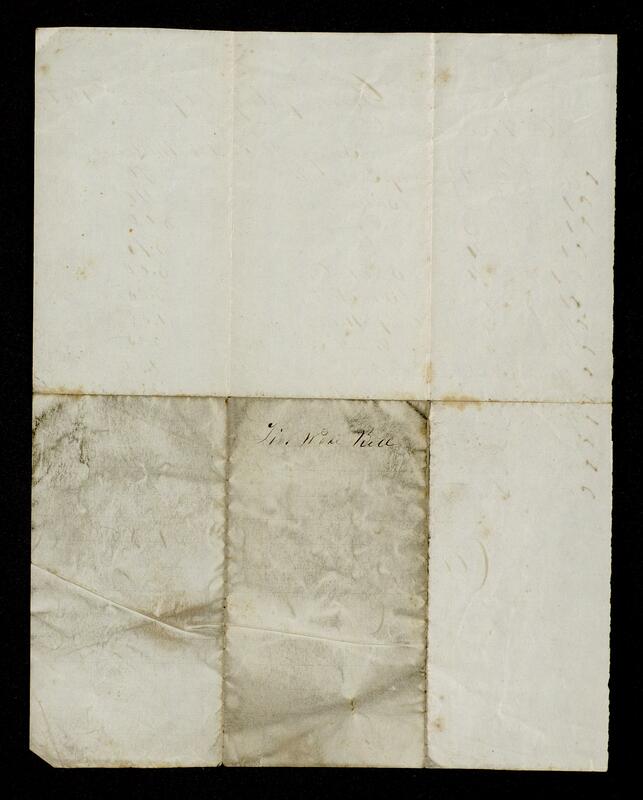 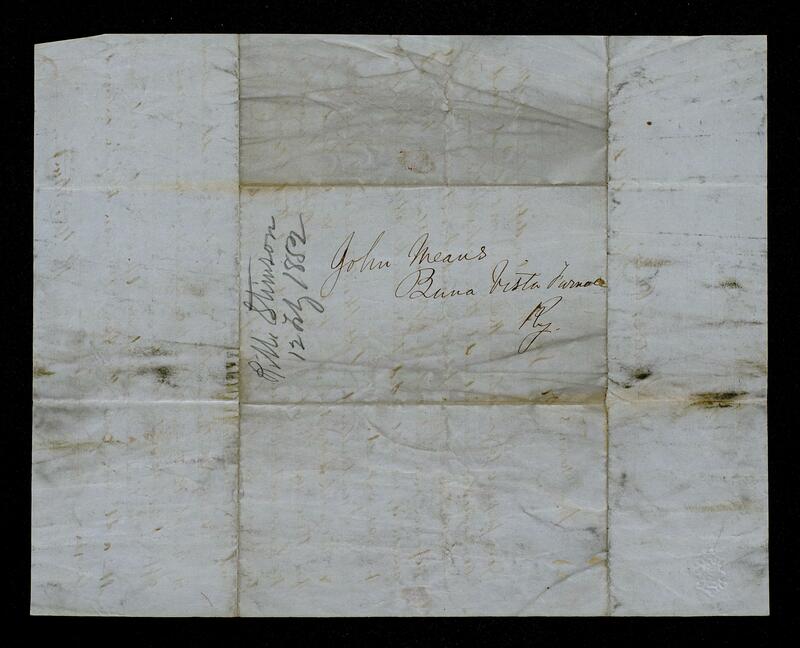 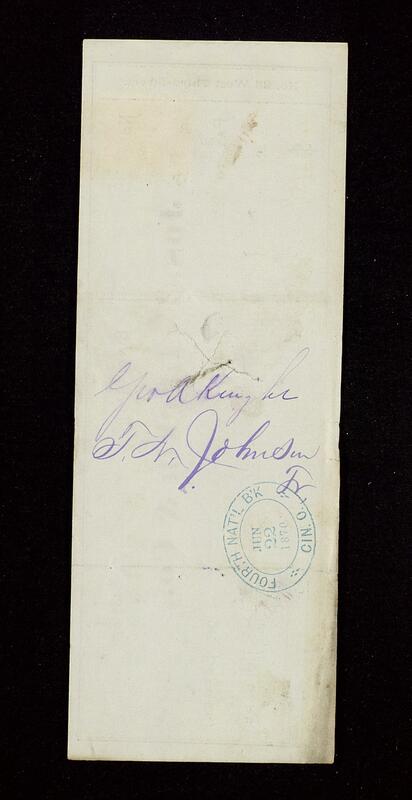 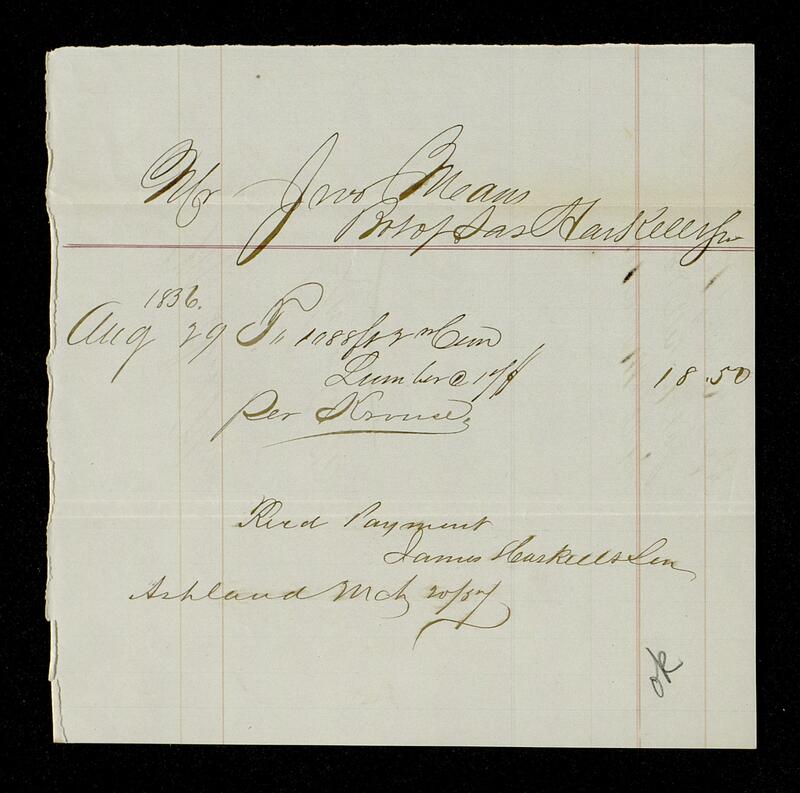 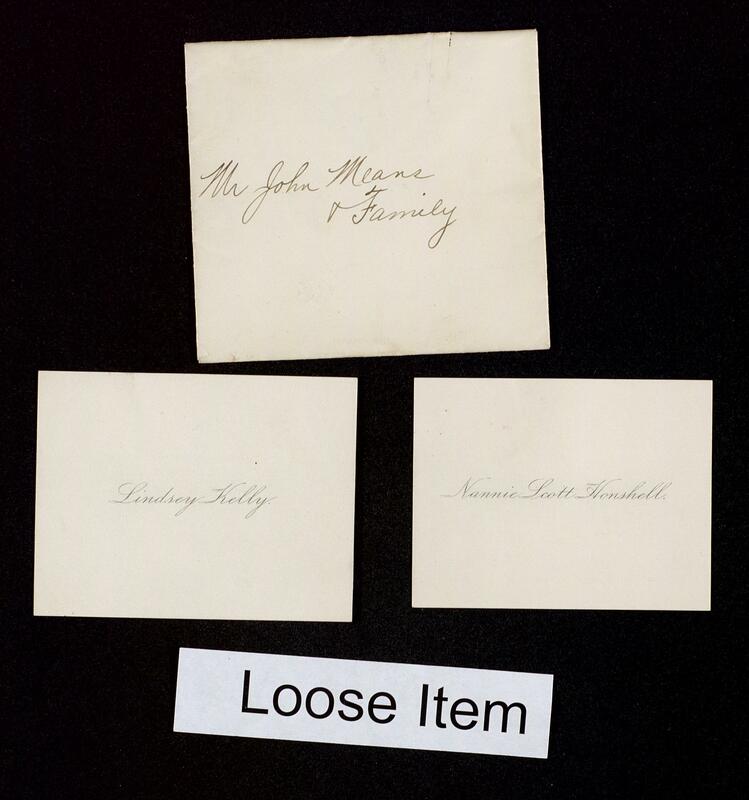 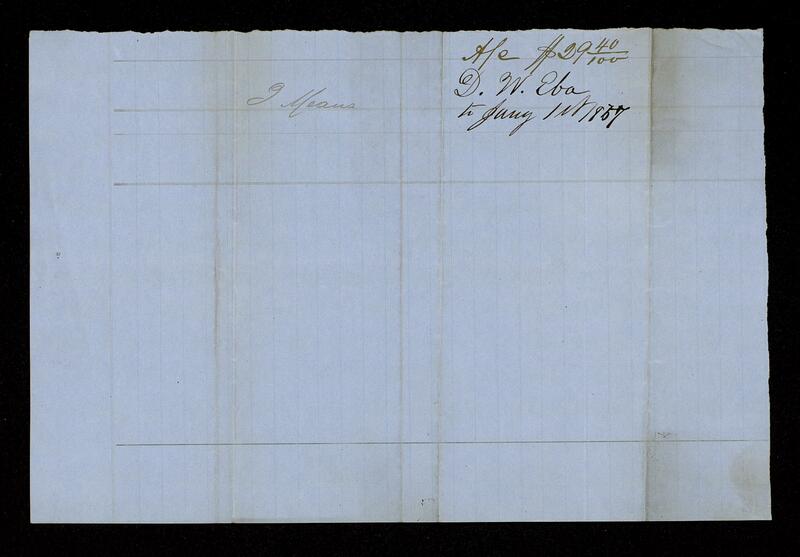 These papers are primarily those of John Means (1821-1910); his wife, Harriet Hildreth Perkins Means (1826-1895); their son E.C. 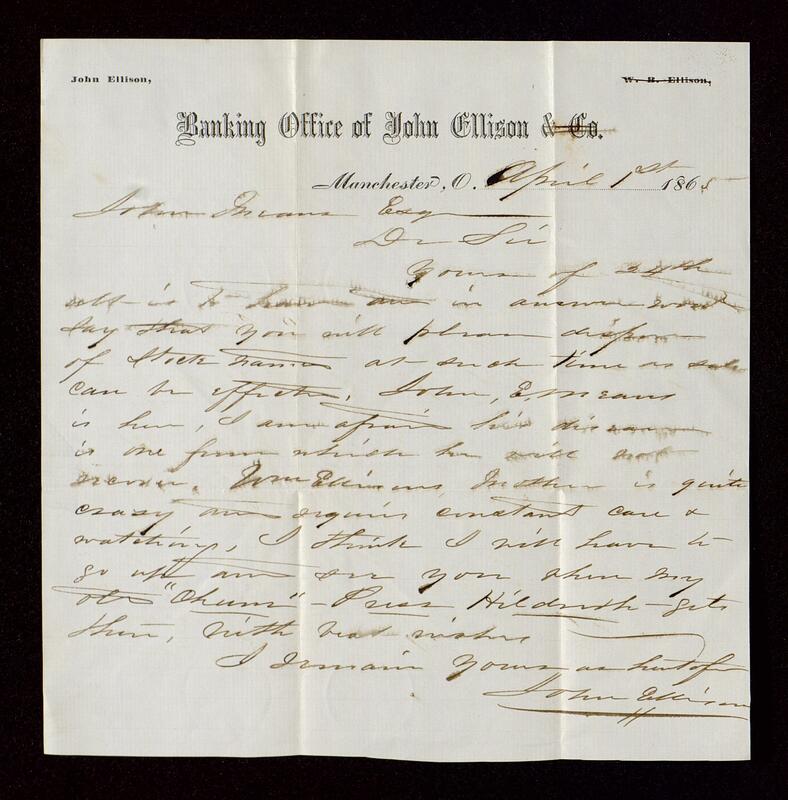 (Ellison Cooke) Means (1864-1956); his brother William (d. 1837); his uncle Hugh Means; his grandfather, Colonel John Means (1770-1837); and his aunt, Margaret A. 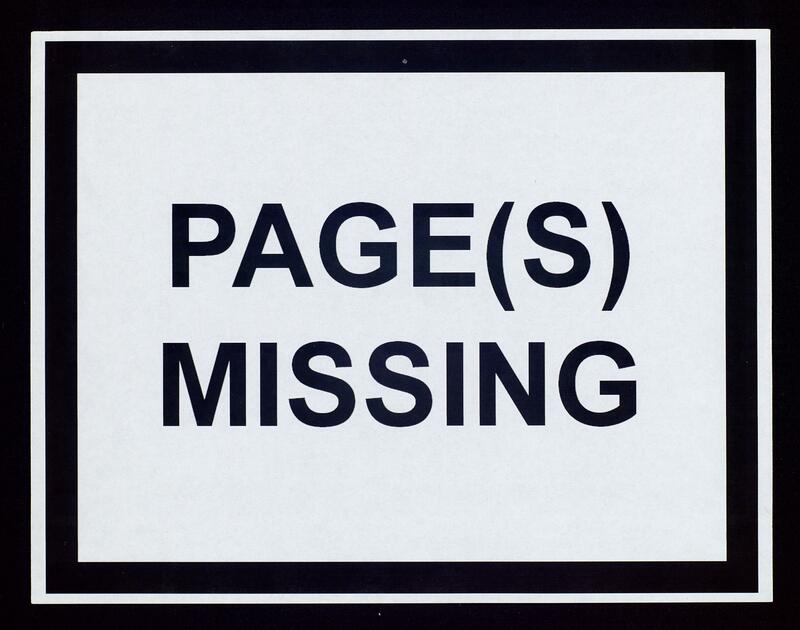 Means. 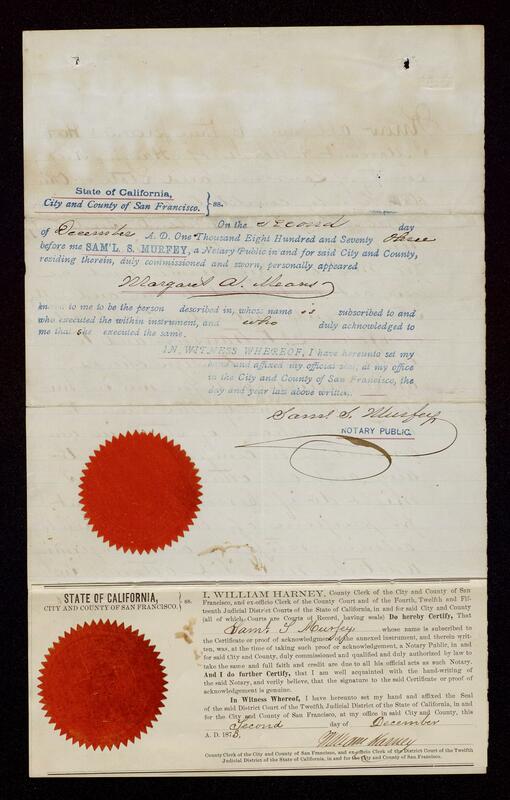 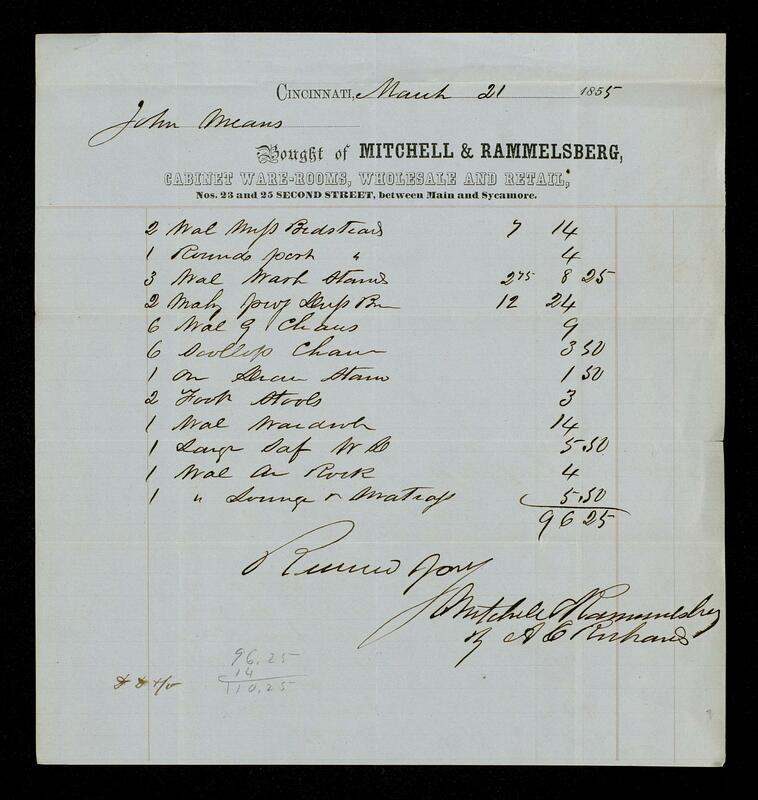 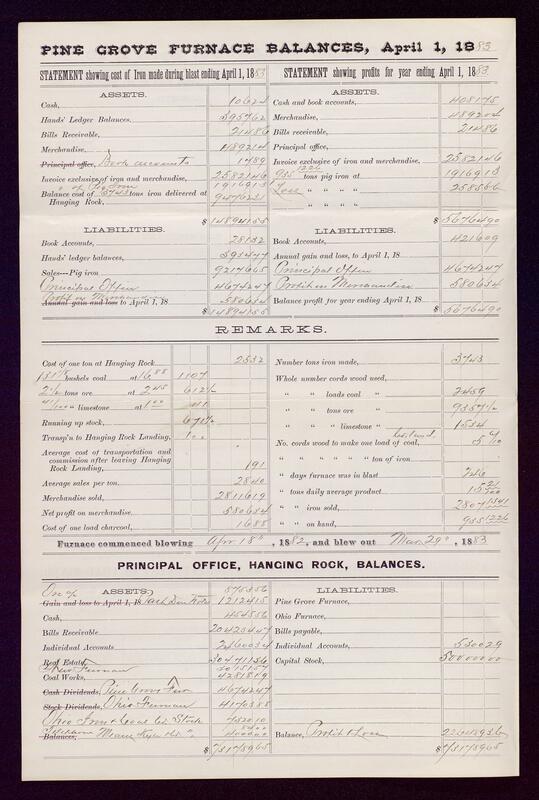 Materials include both personal and business-related correspondence, financial records, legal documents, memorabilia, newspaper clippings, journals, scrapbooks, and photographs. 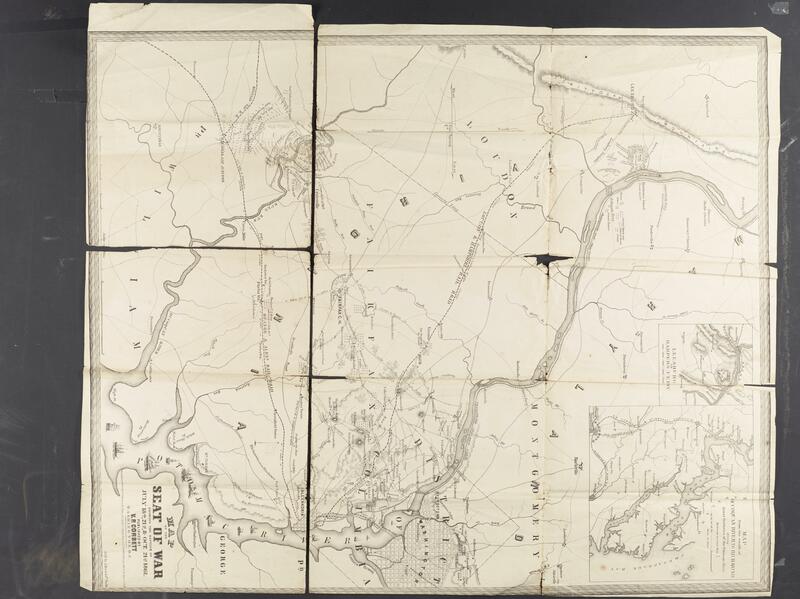 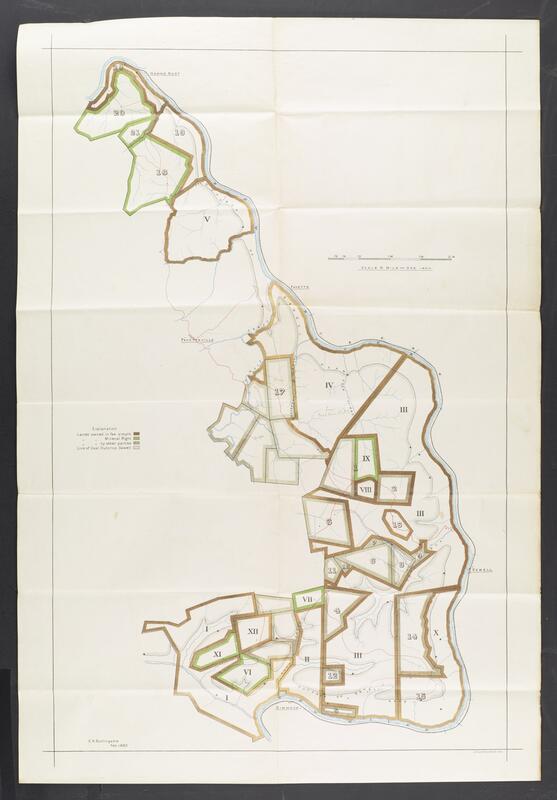 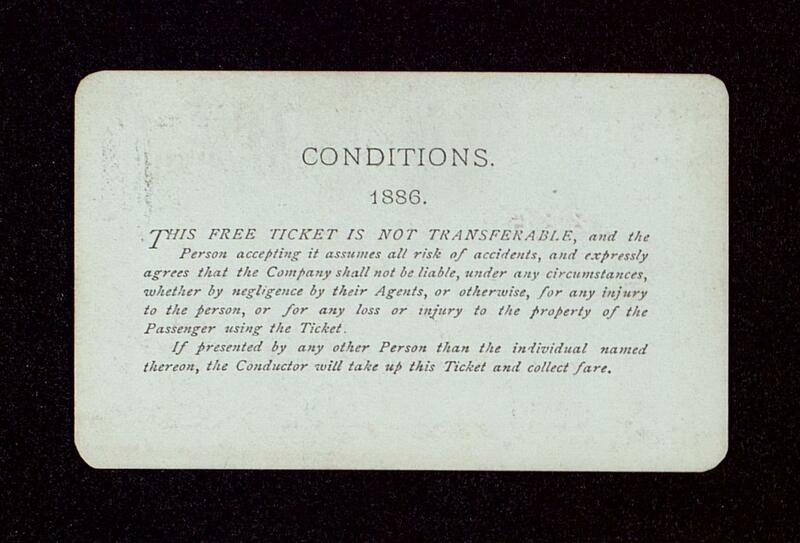 Conditions Governing Access Collection is open for research. 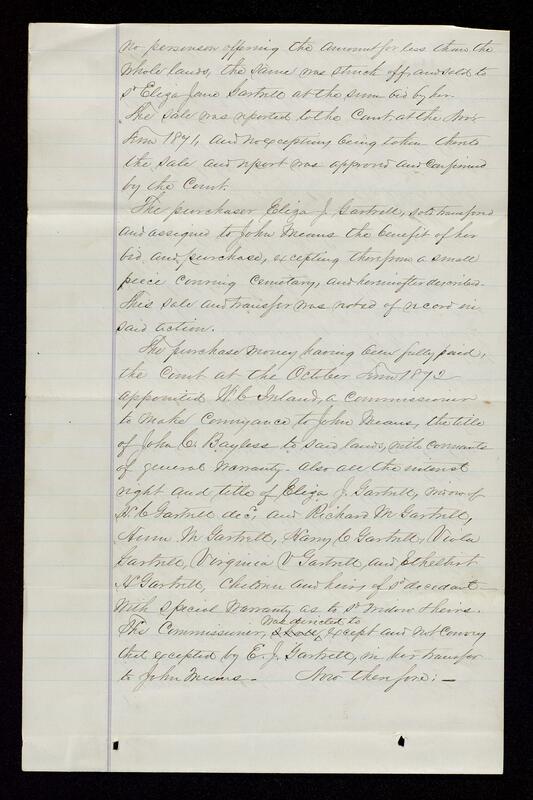 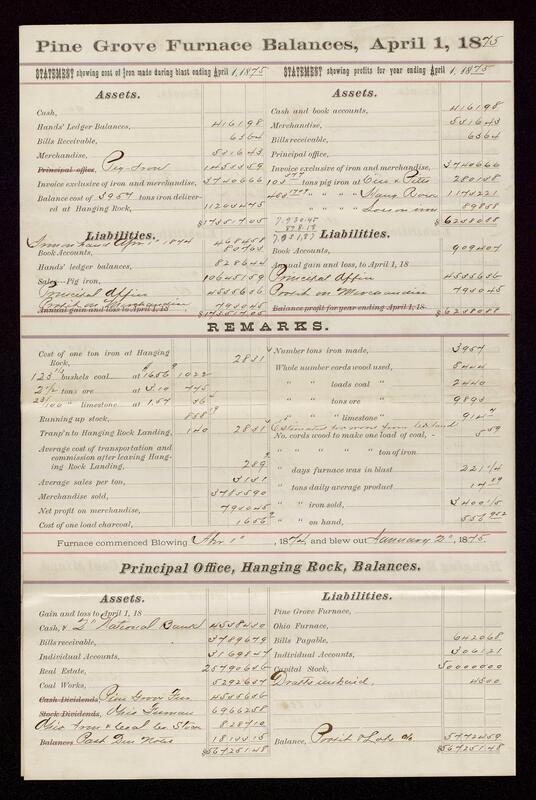 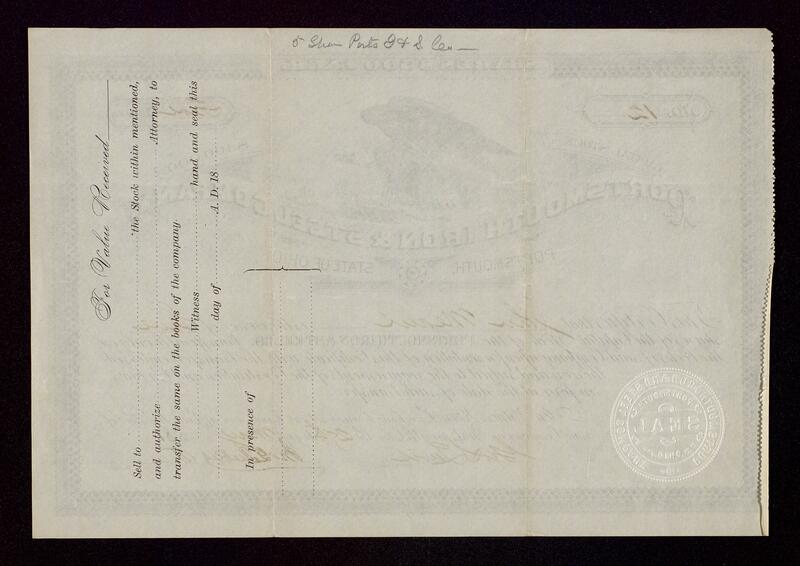 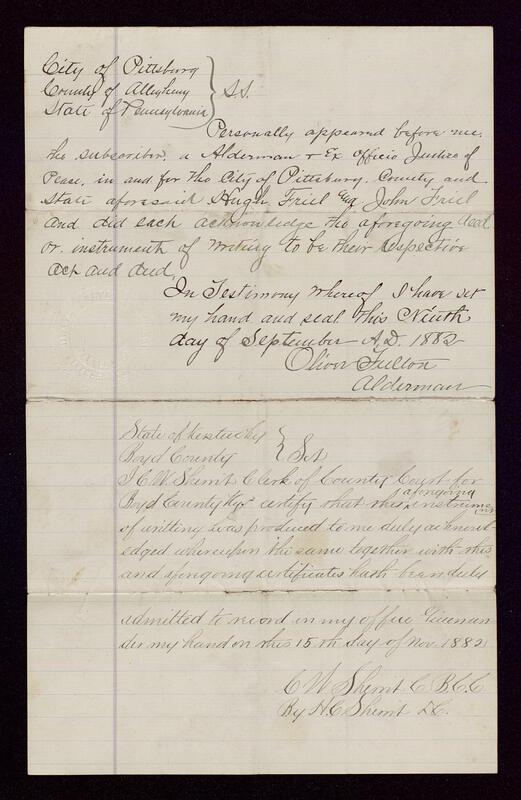 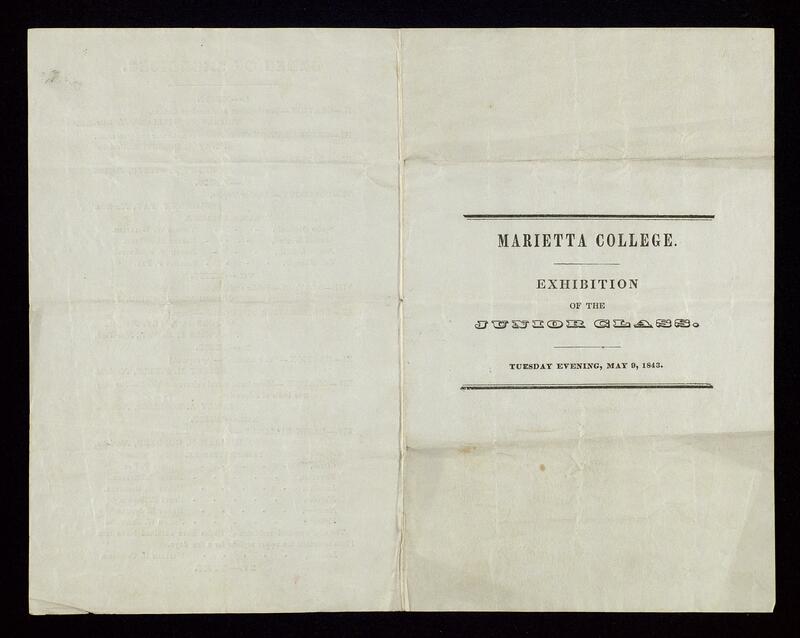 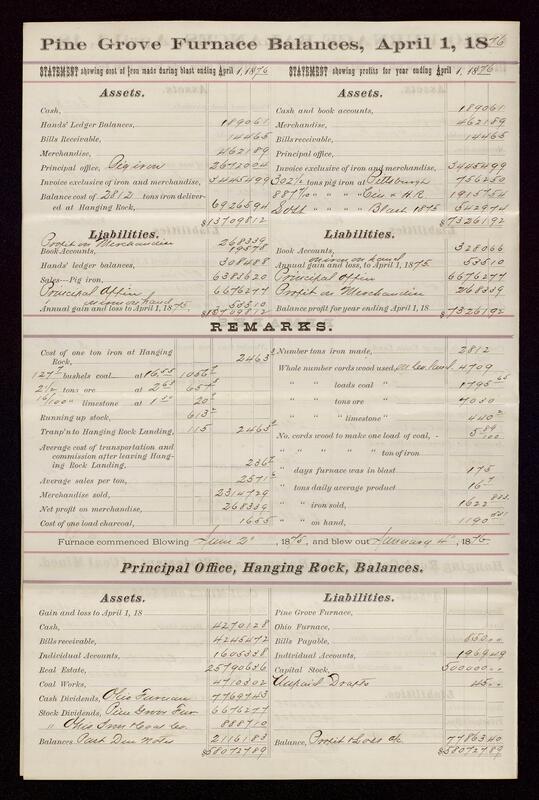 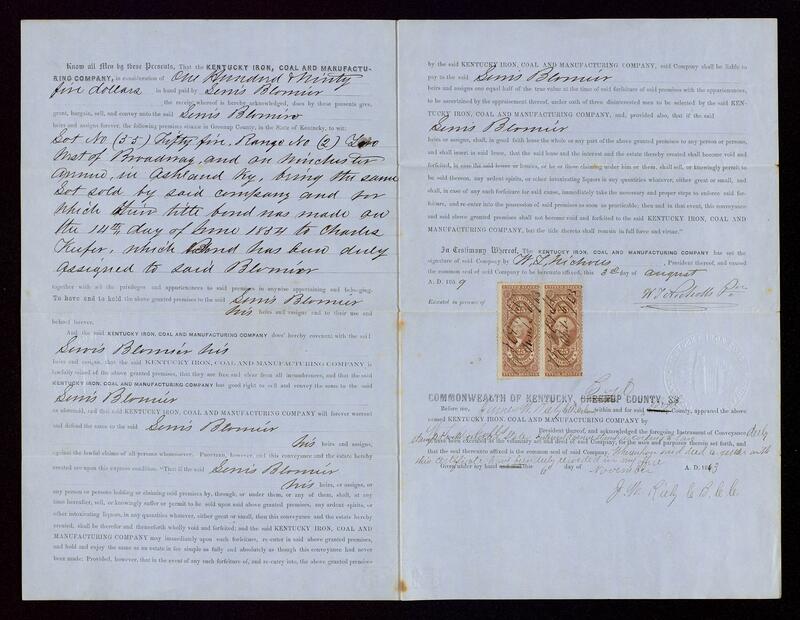 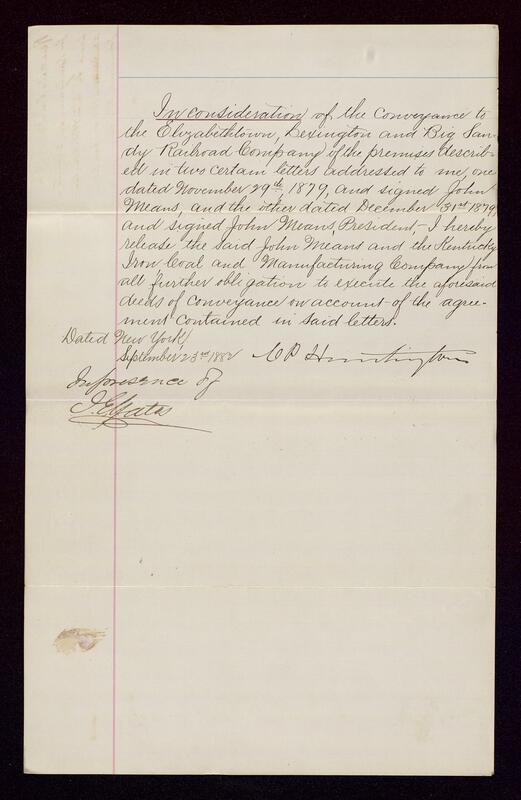 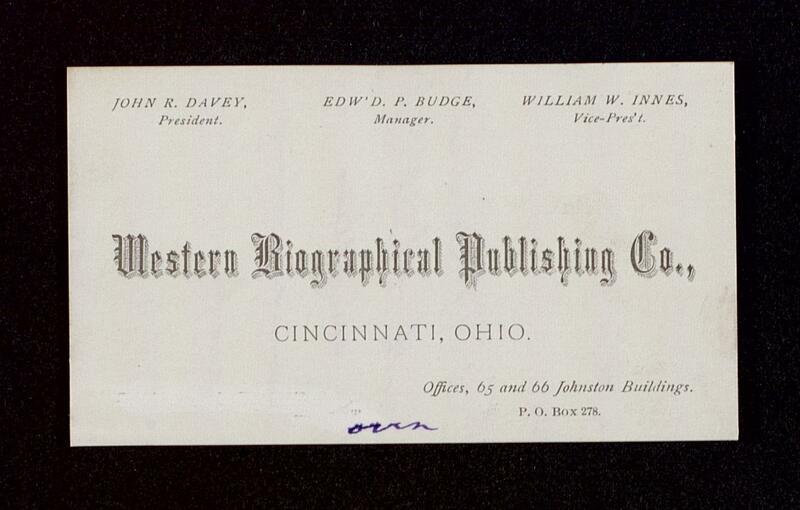 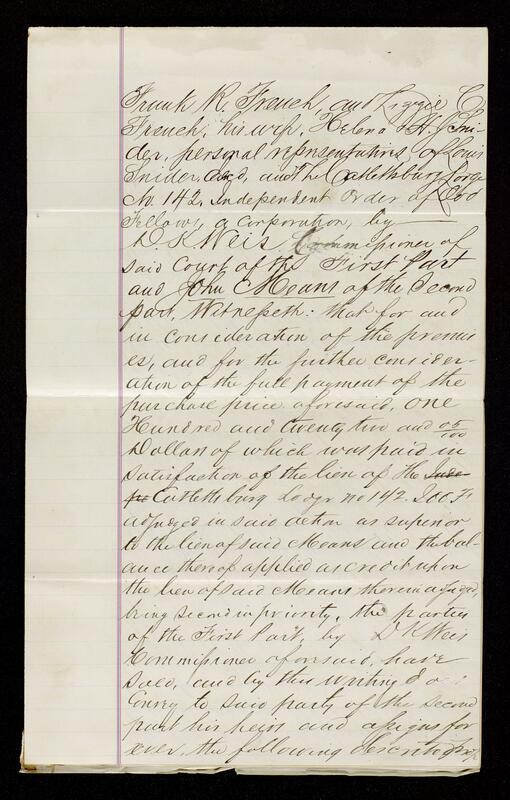 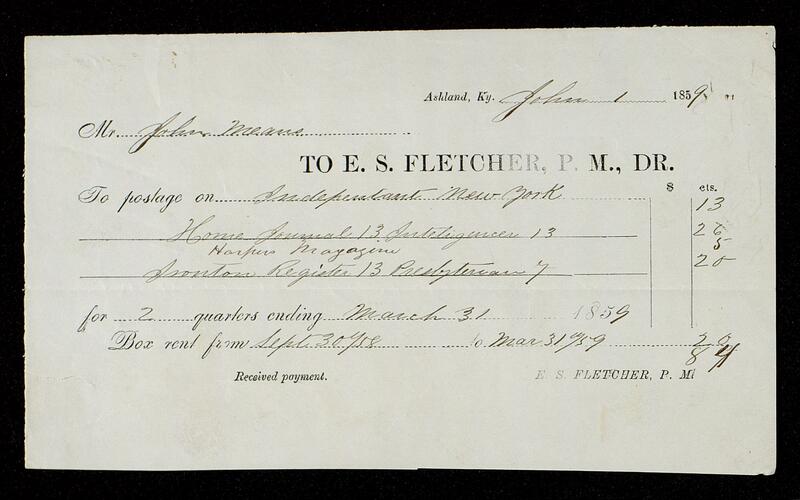 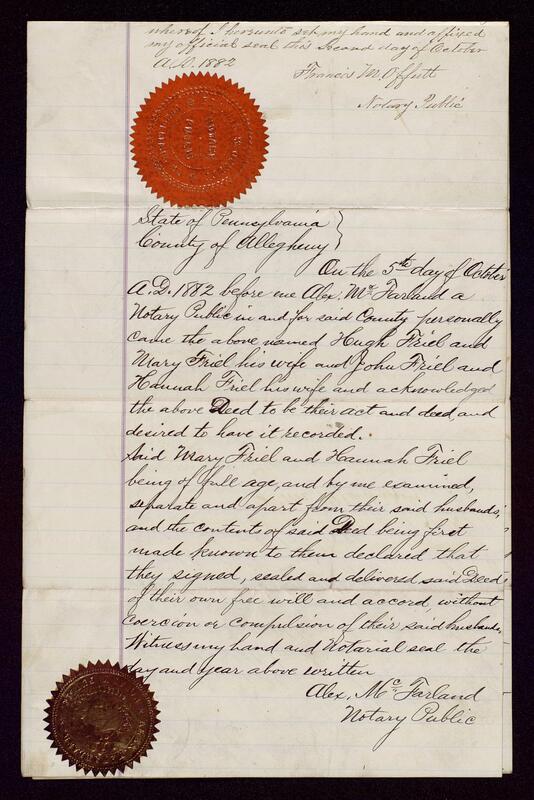 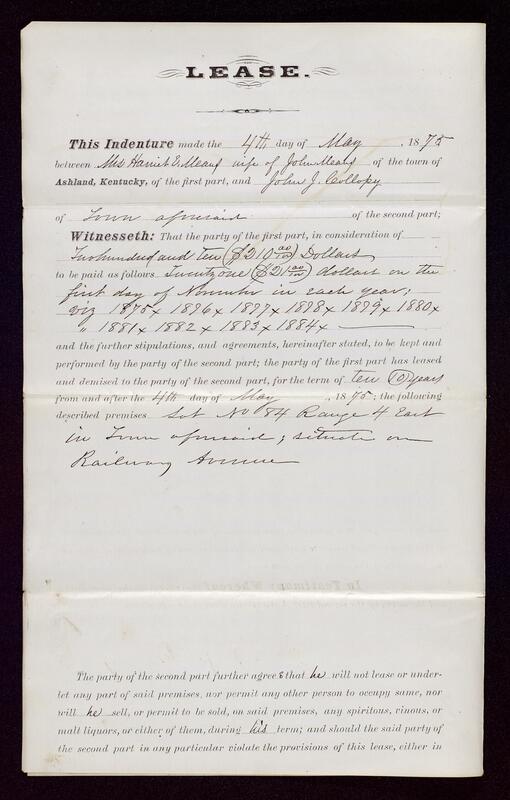 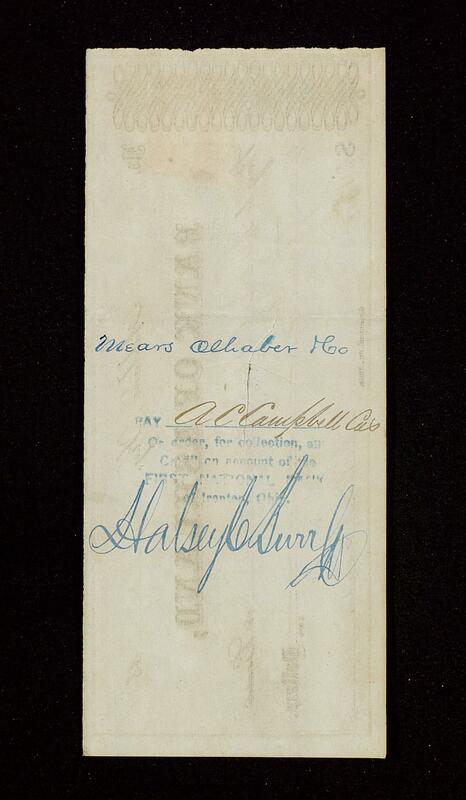 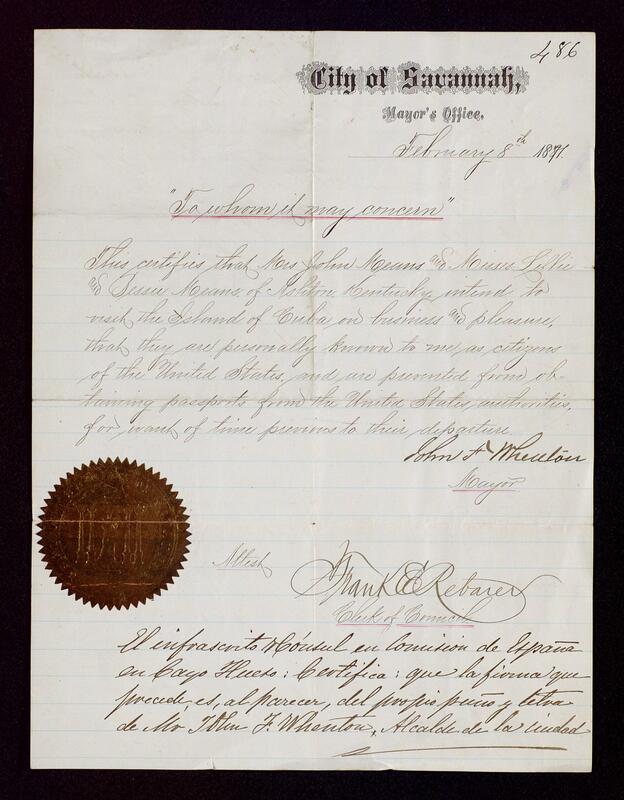 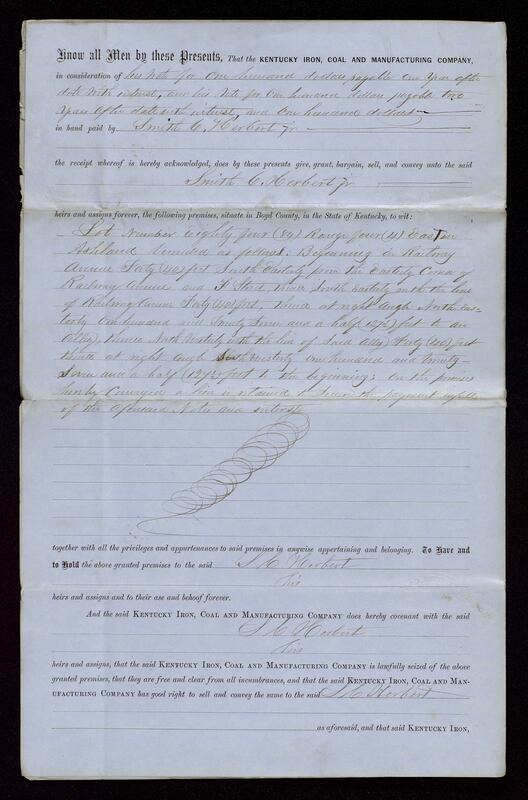 Papers from this period include Harriet Hildreth's school essays and personal correspondence; programs for events at Marietta College; a certificate showing the appointment of John Means as Postmaster of LaBelle, Greenup County, Kentucky; land indentures of Hugh and Thomas W. Means, and various business papers and financial records. 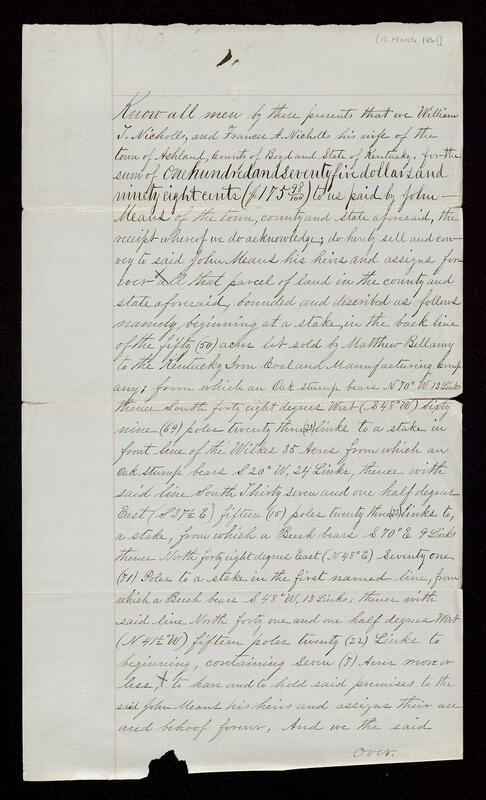 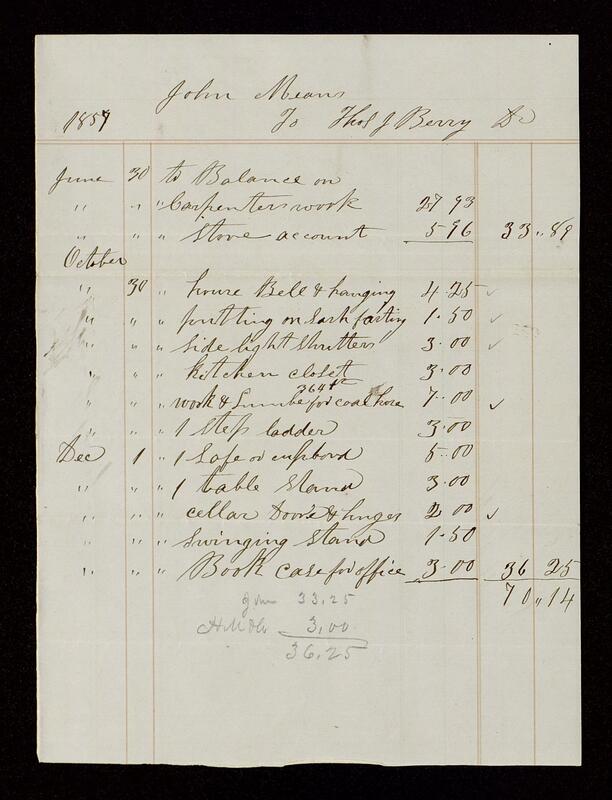 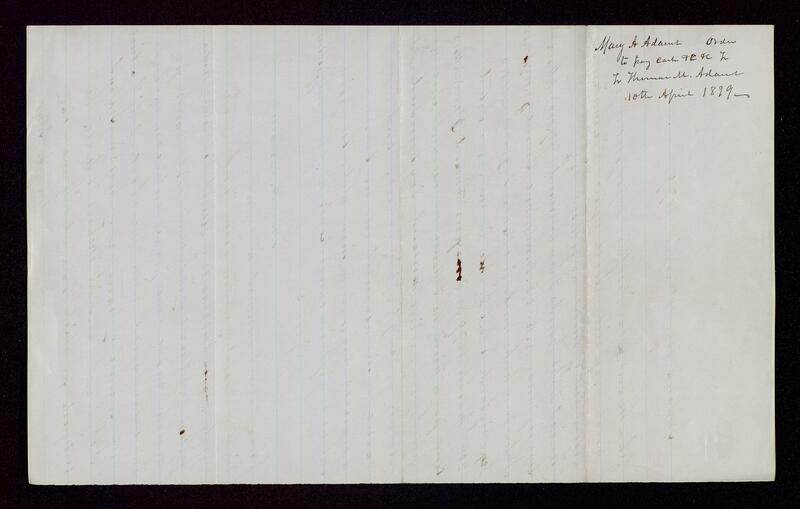 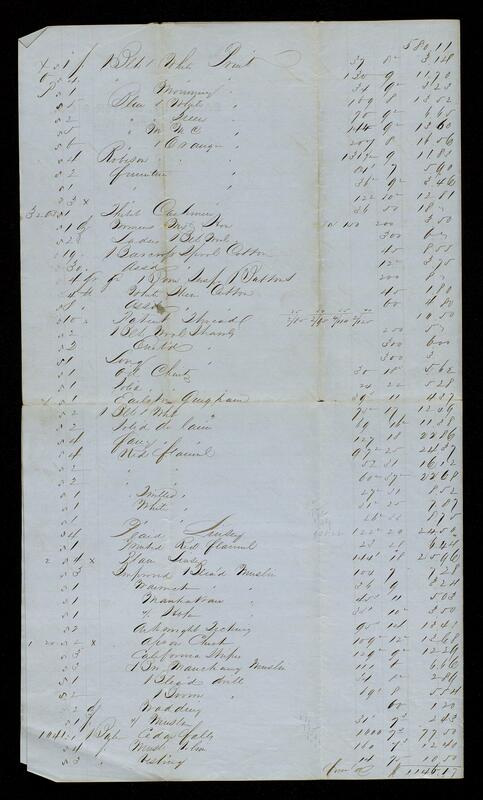 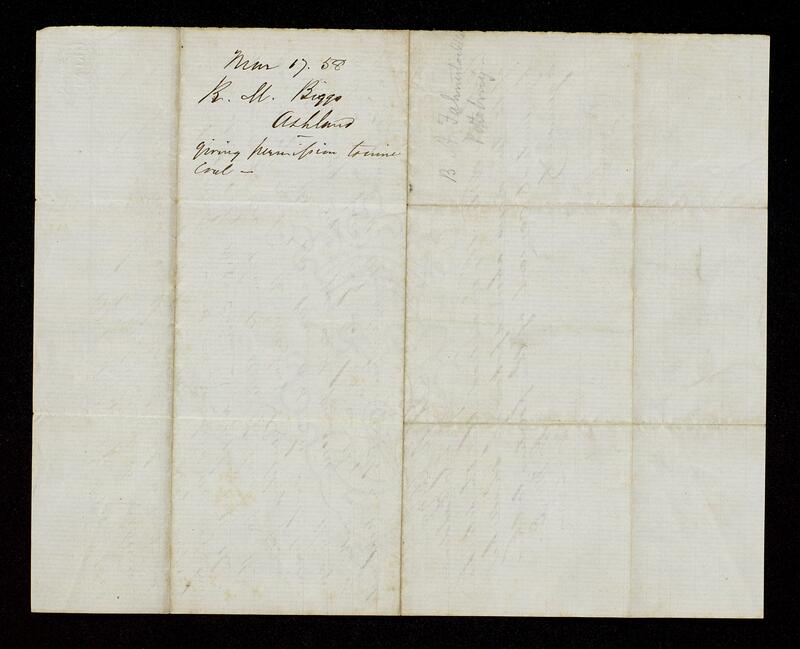 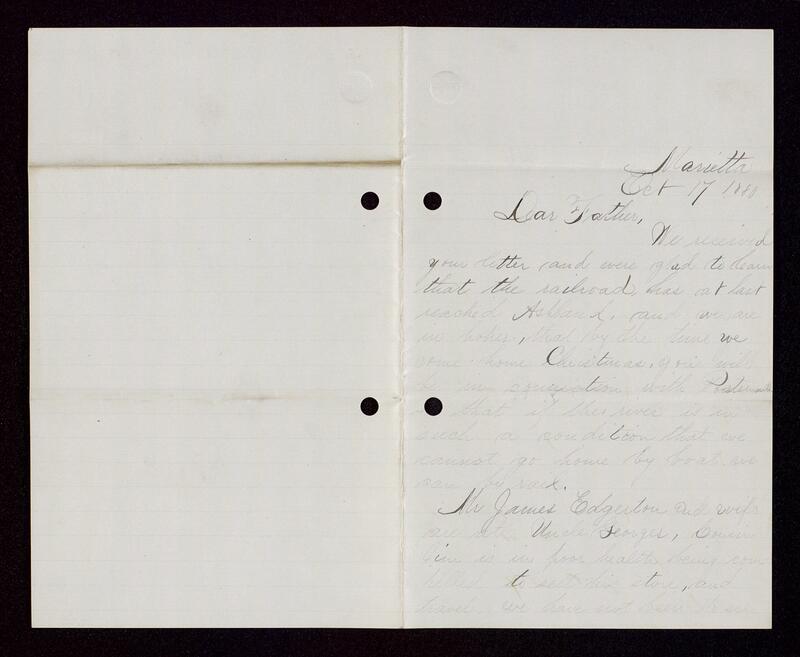 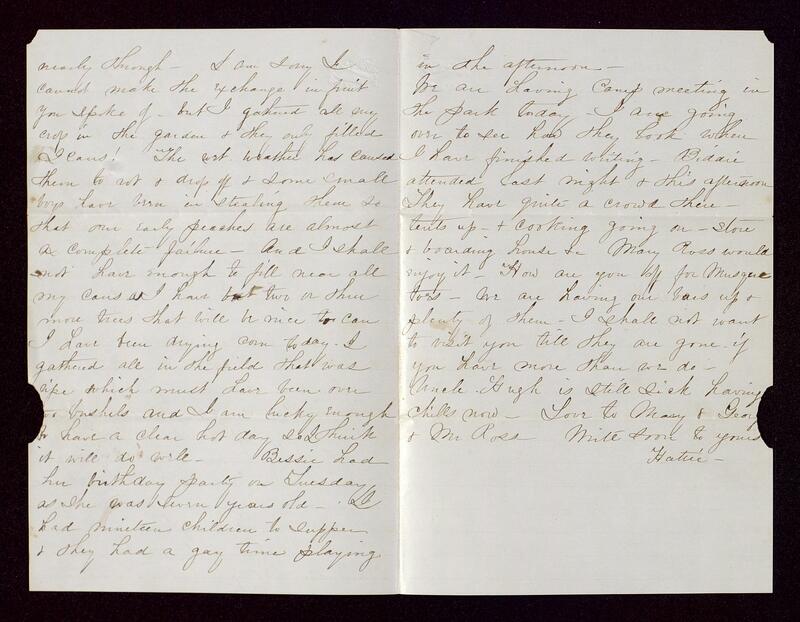 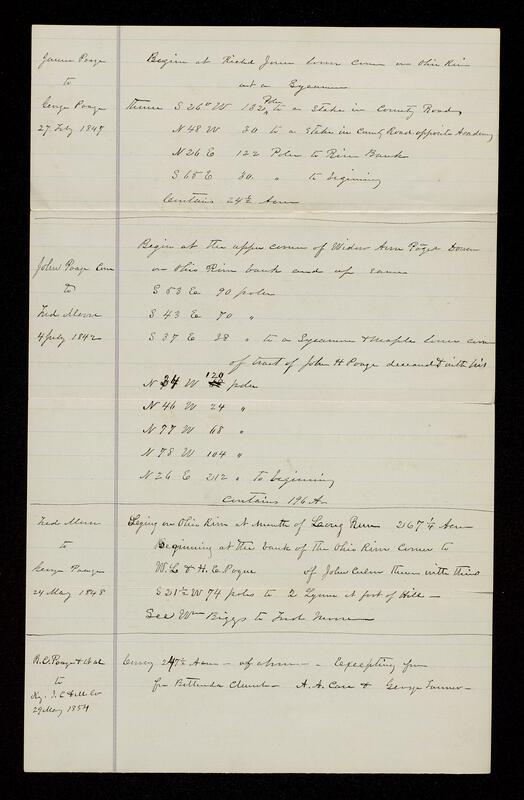 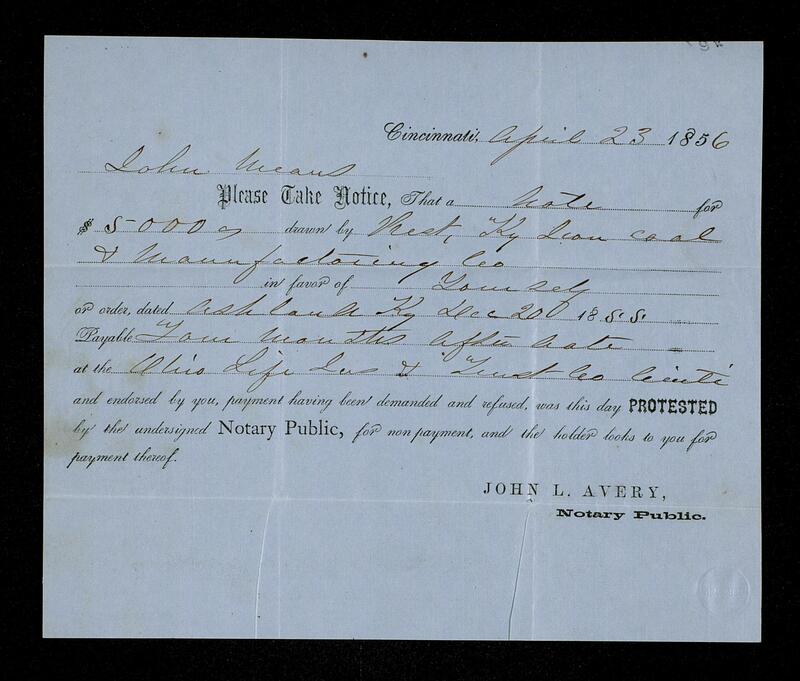 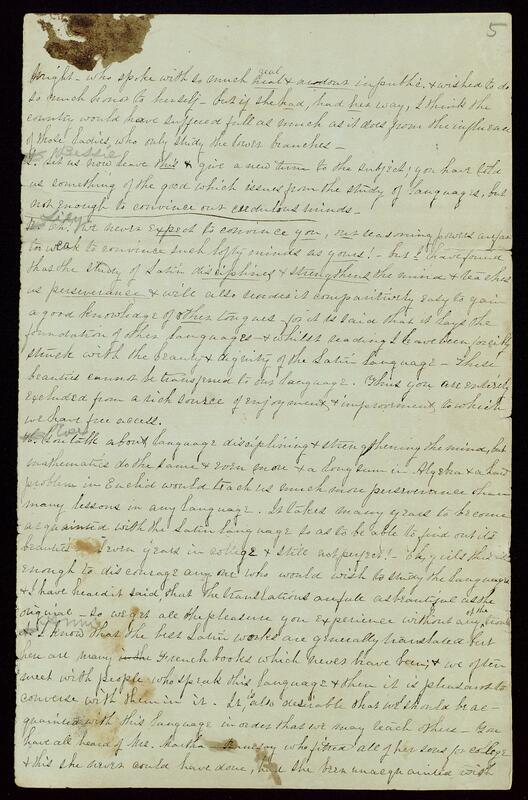 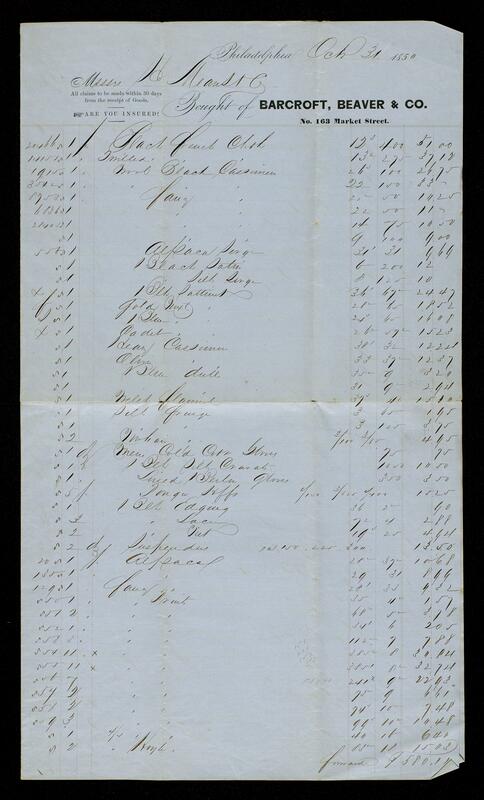 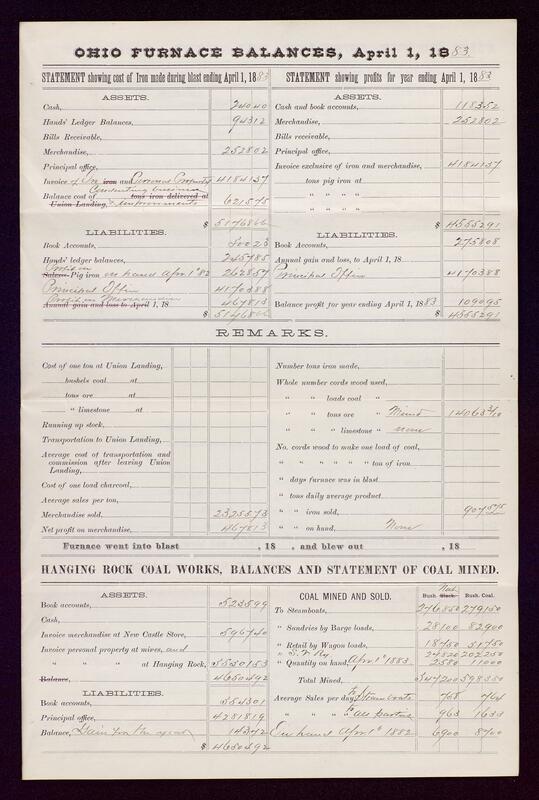 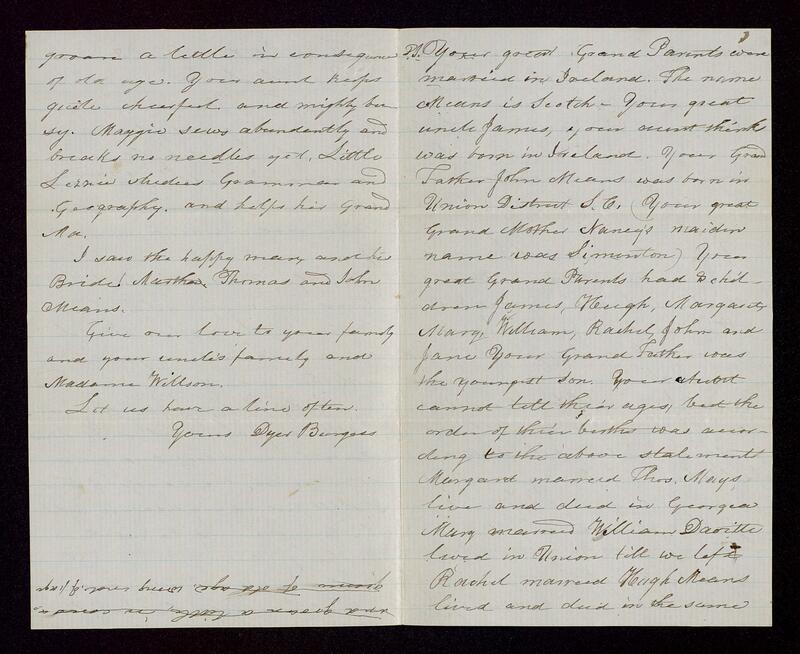 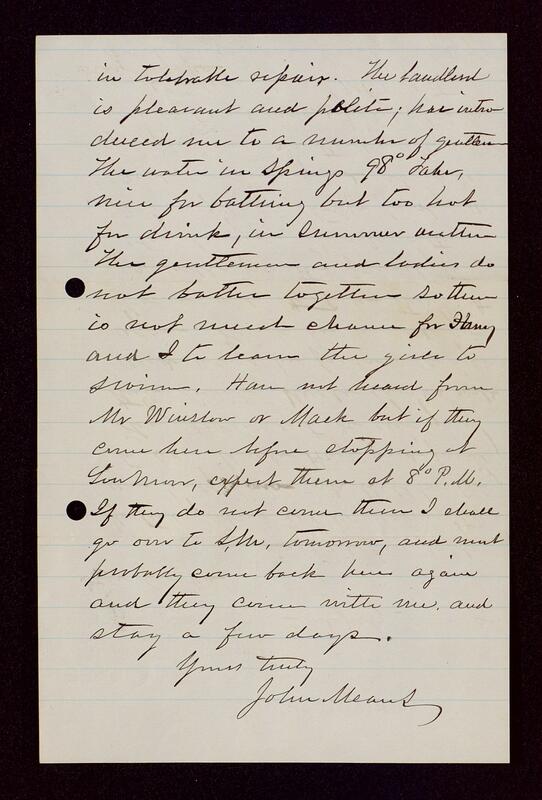 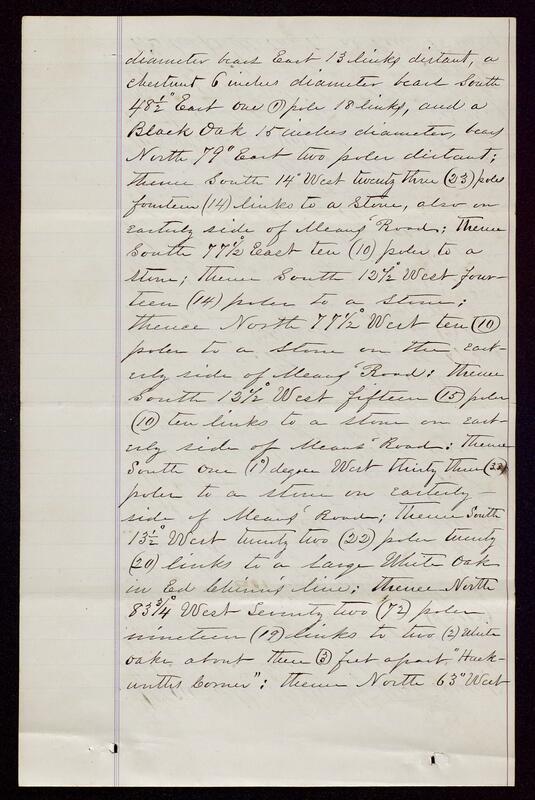 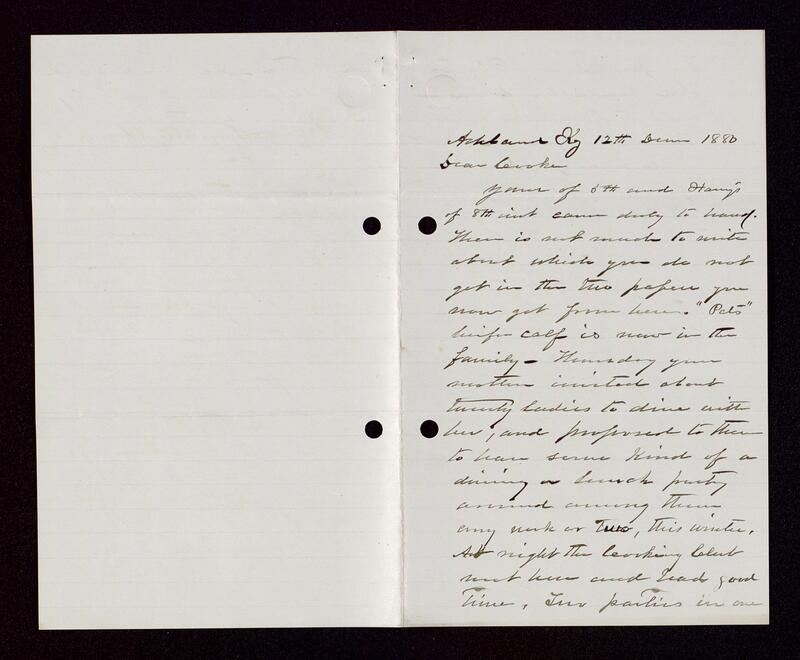 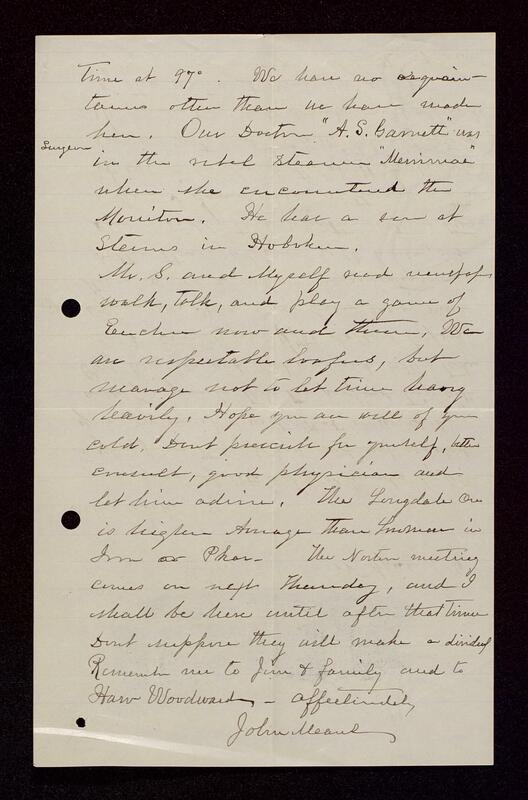 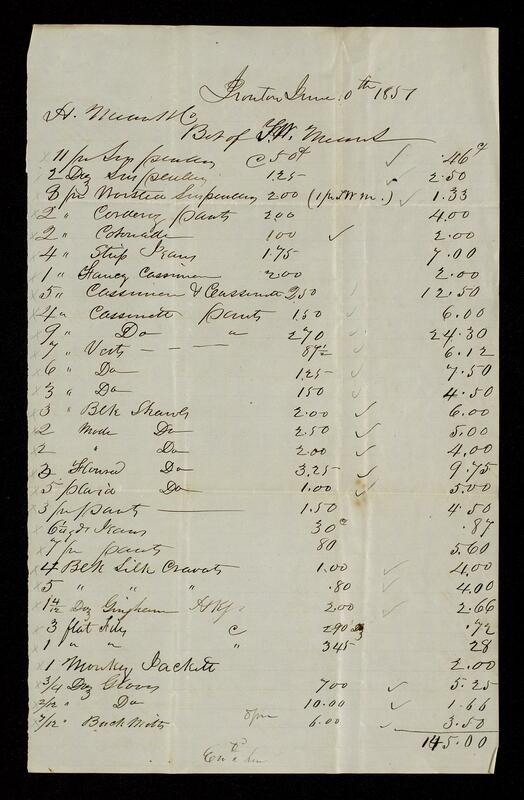 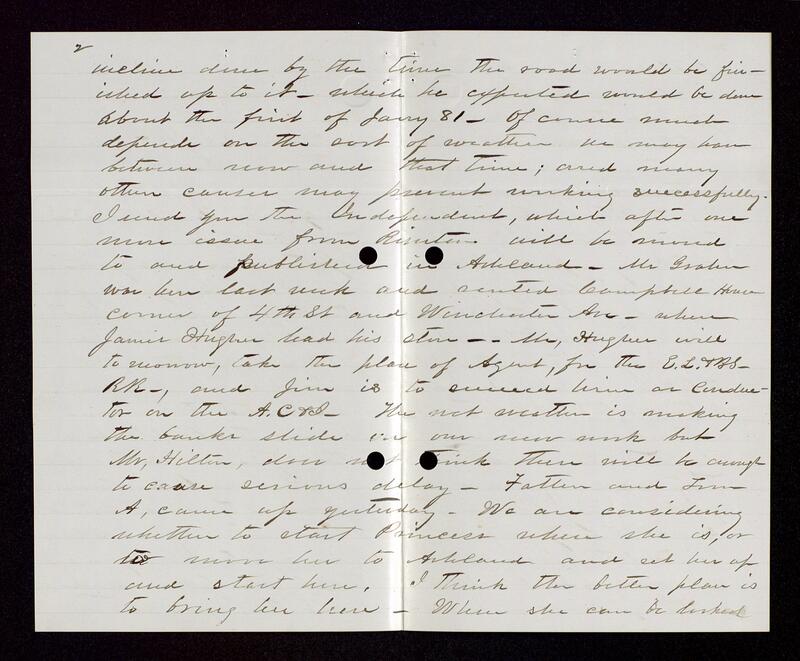 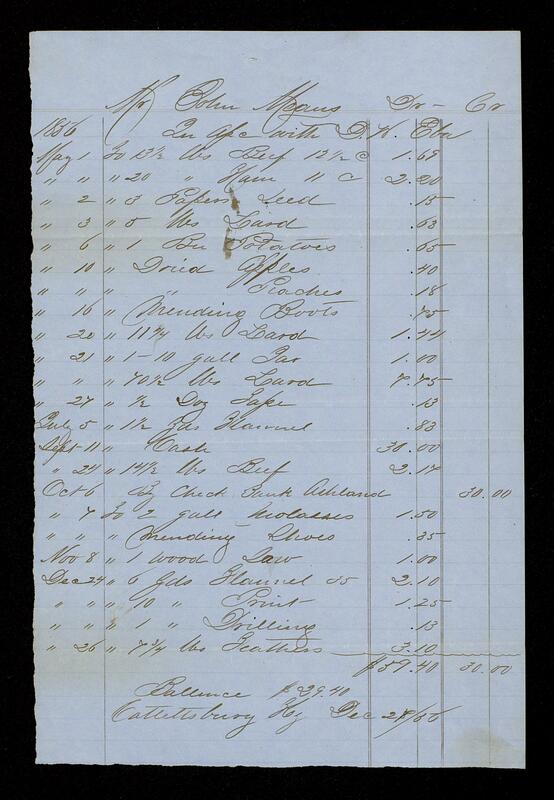 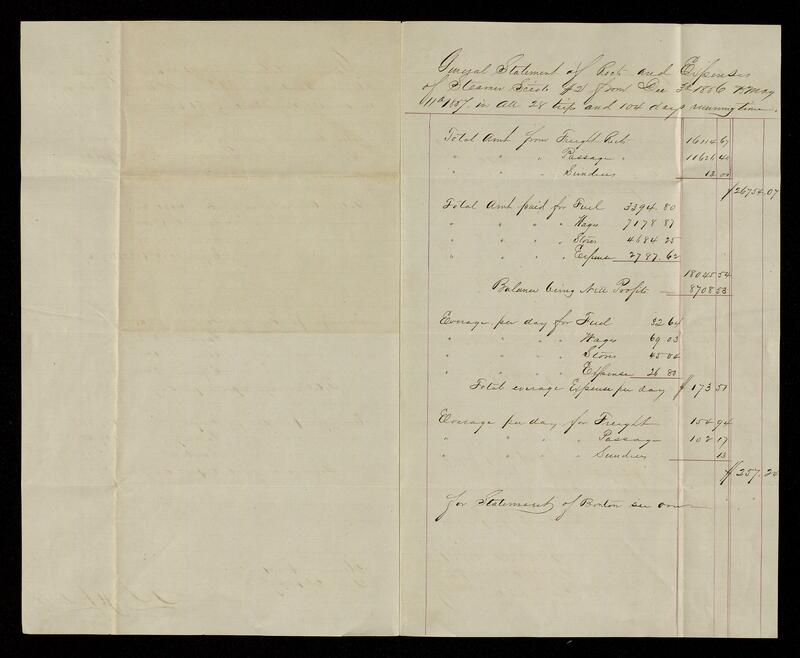 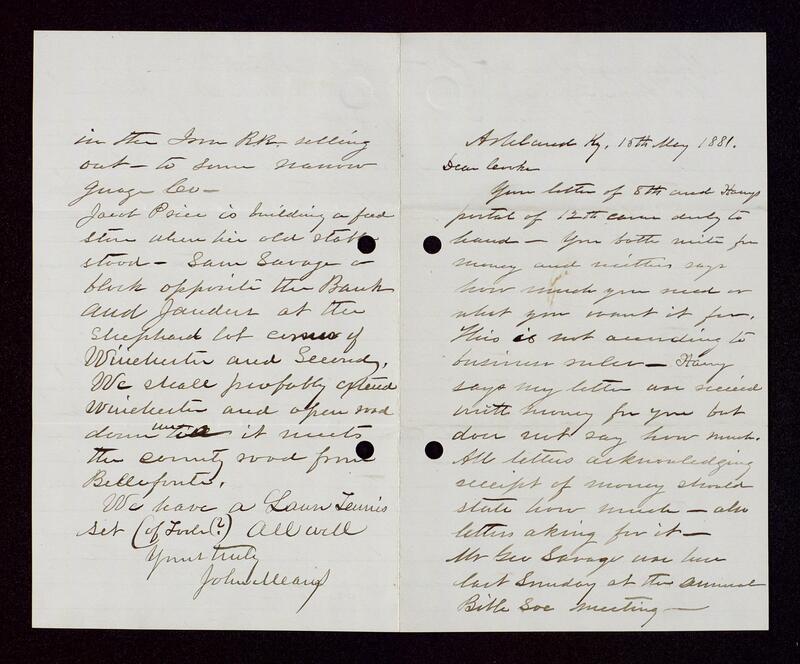 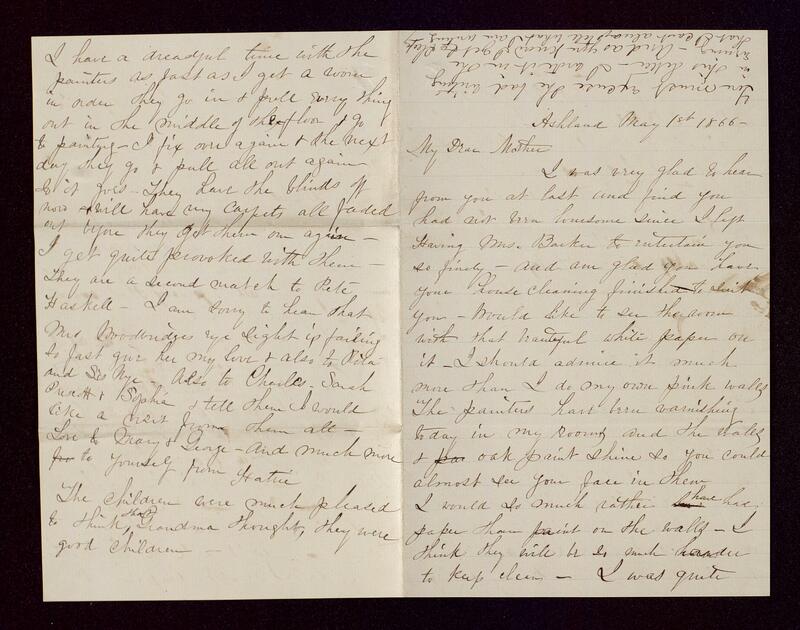 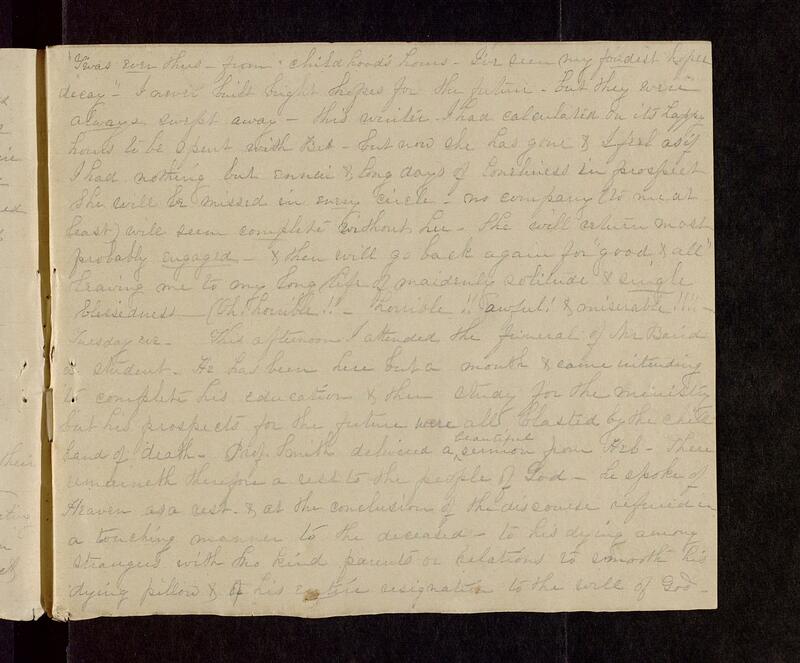 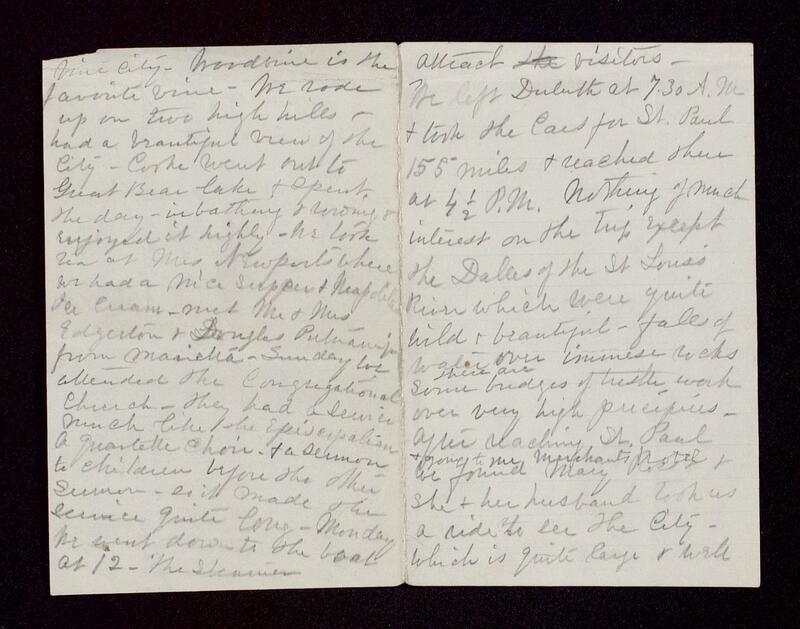 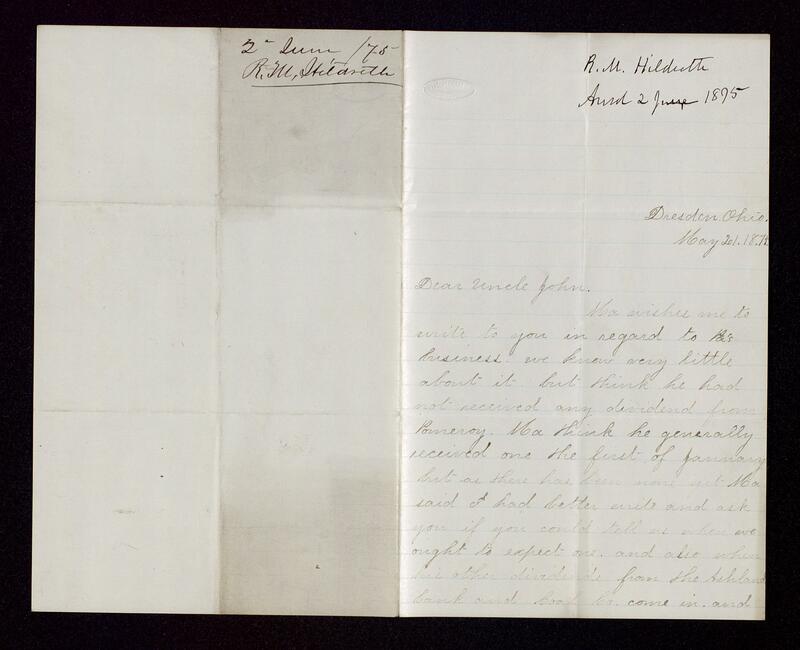 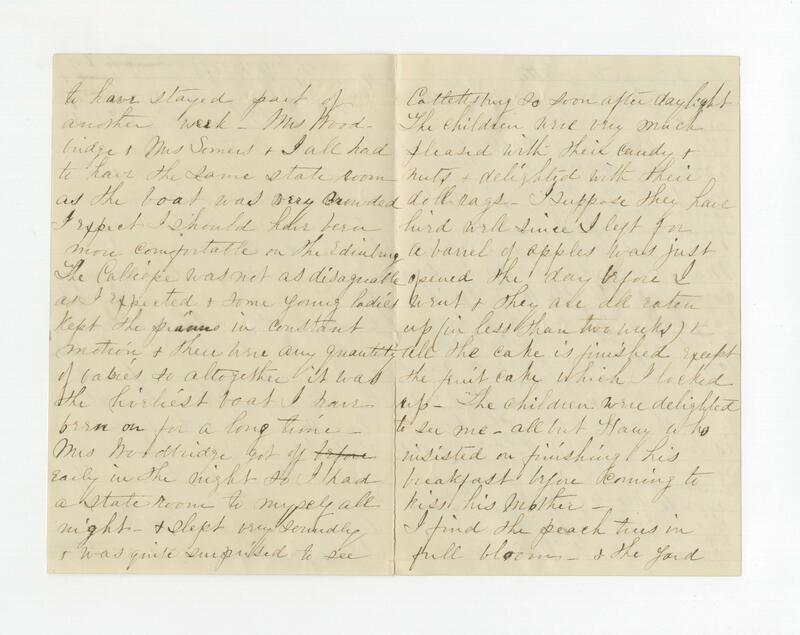 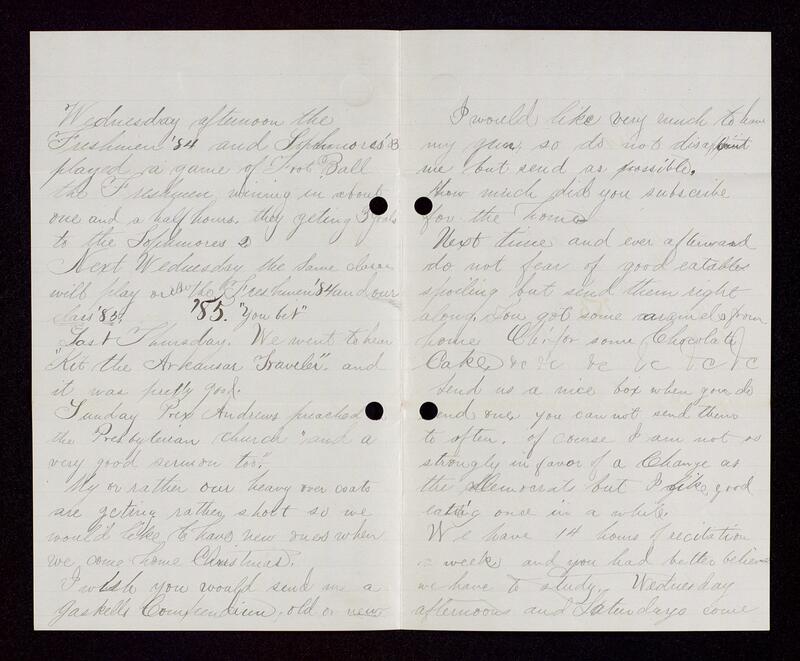 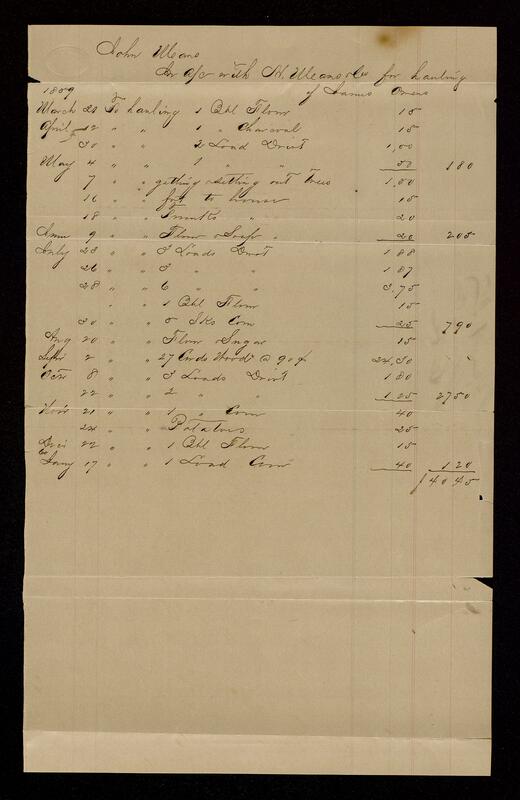 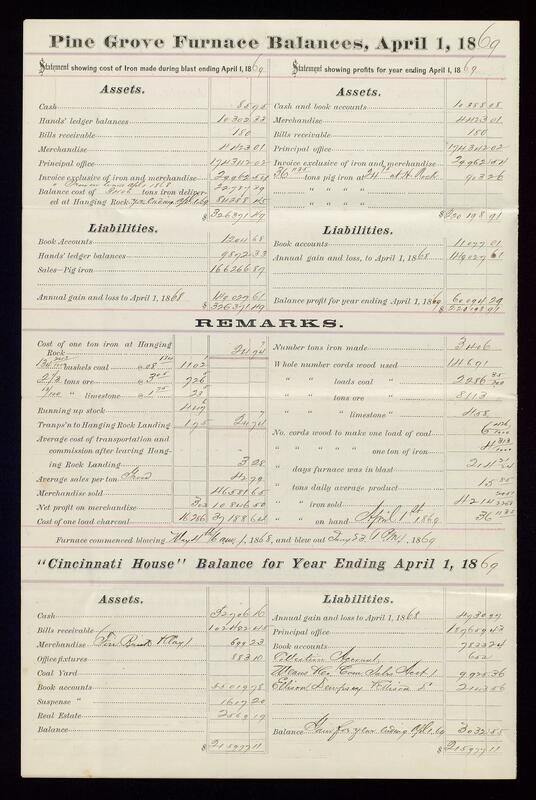 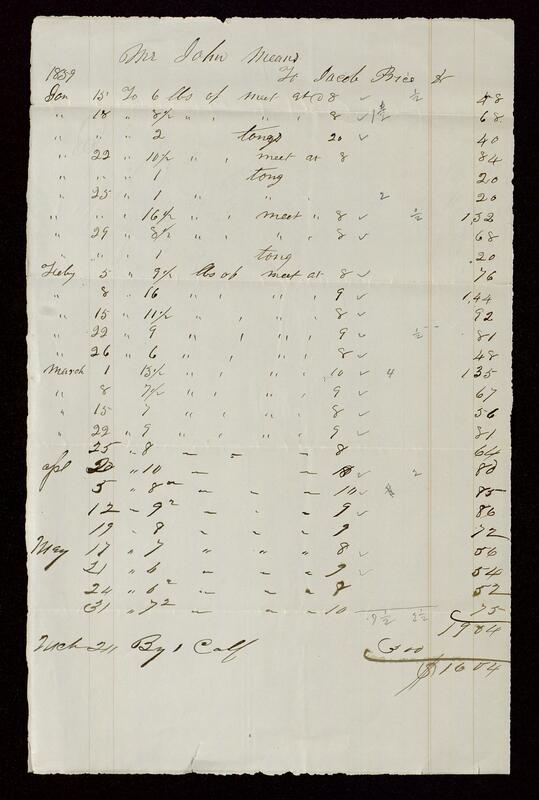 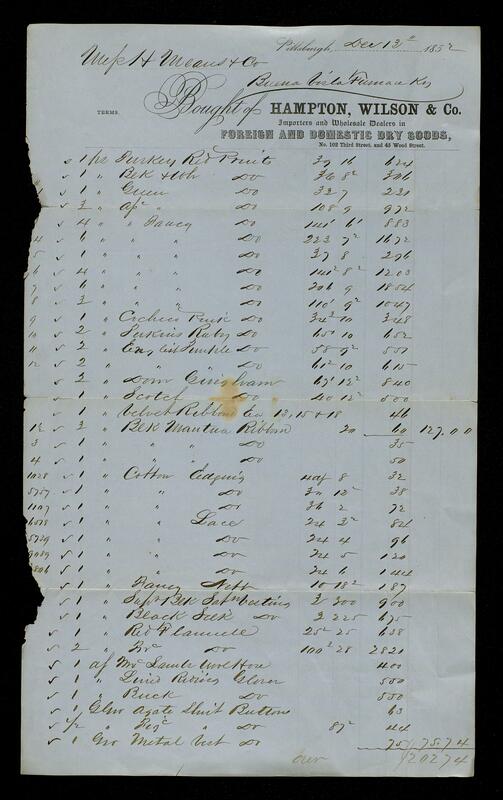 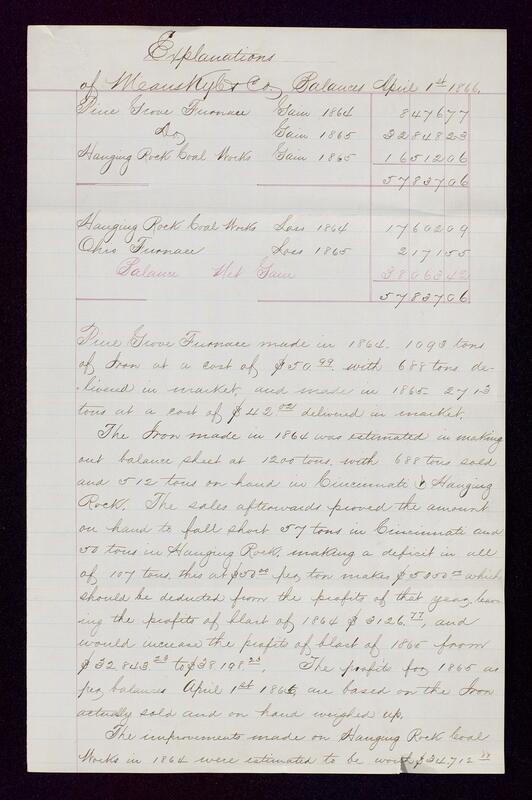 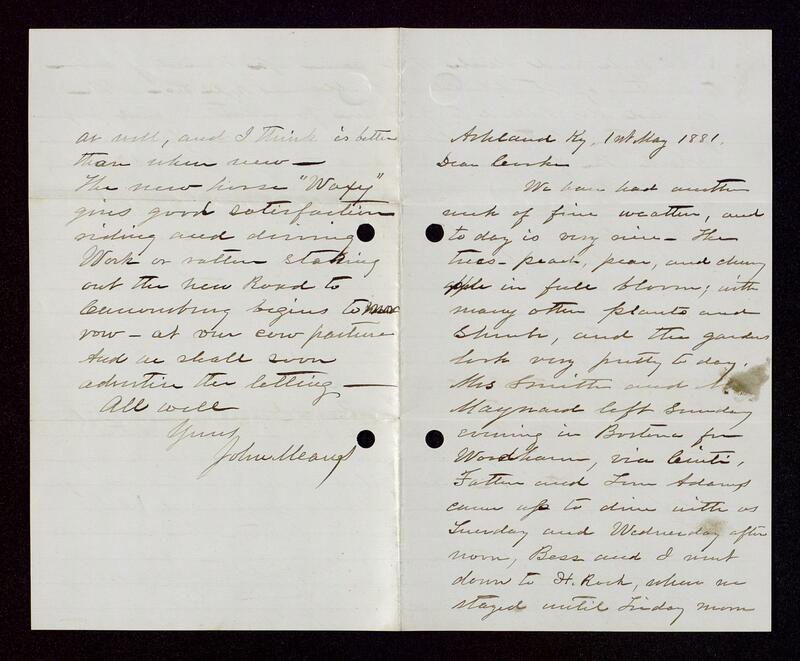 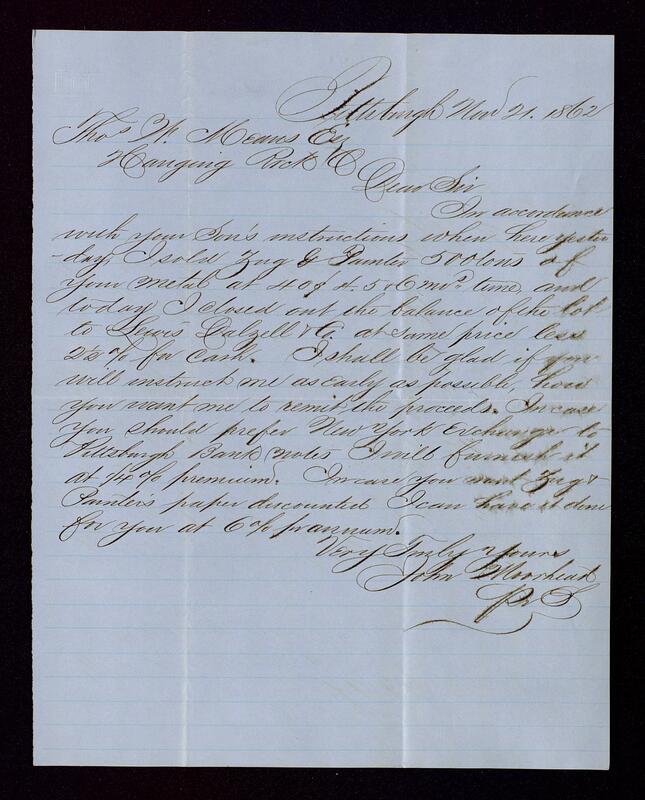 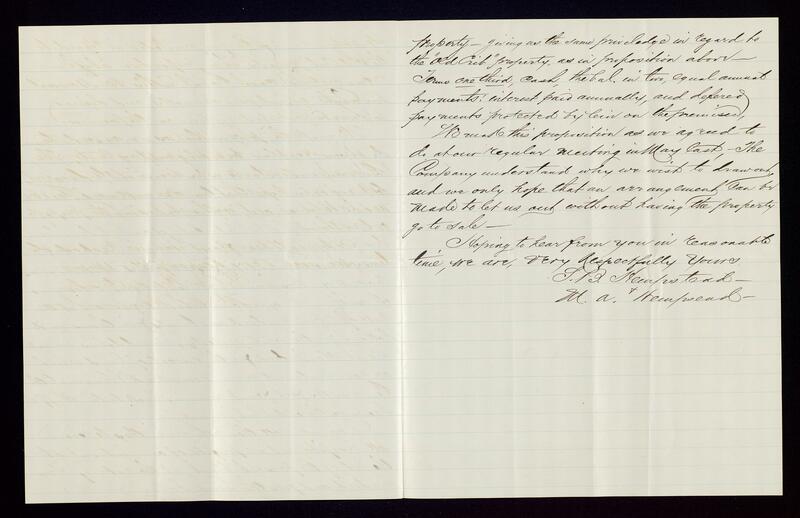 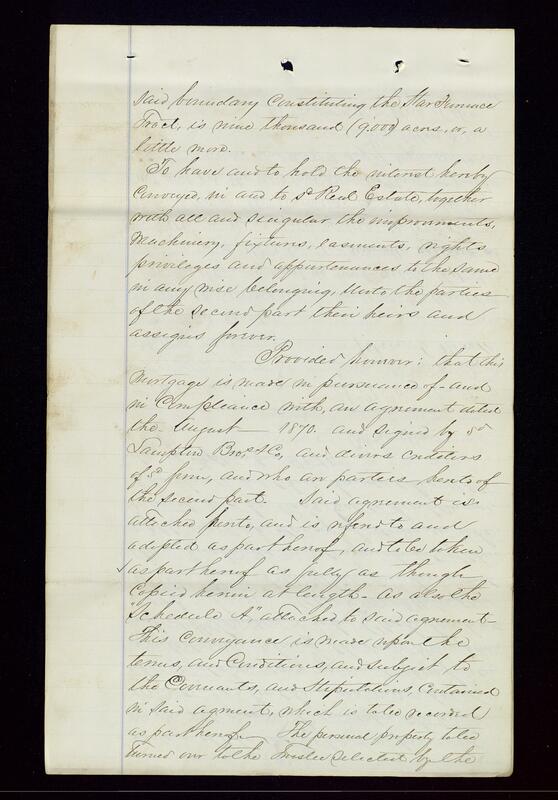 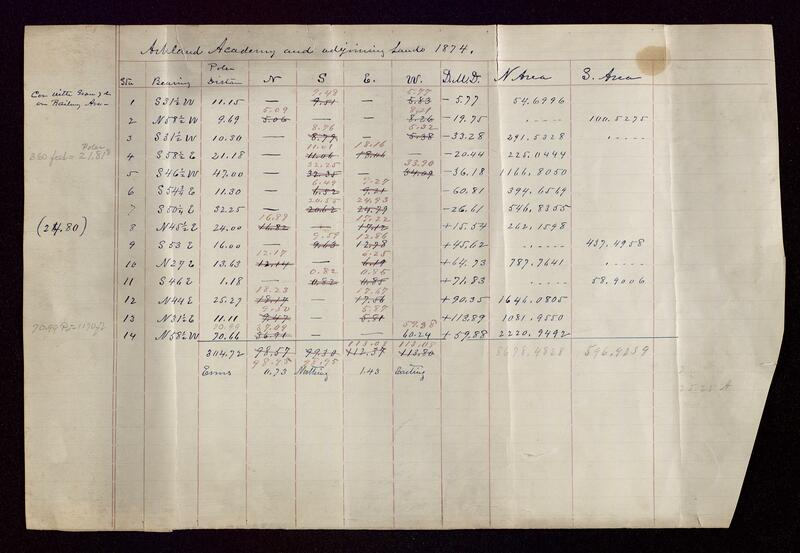 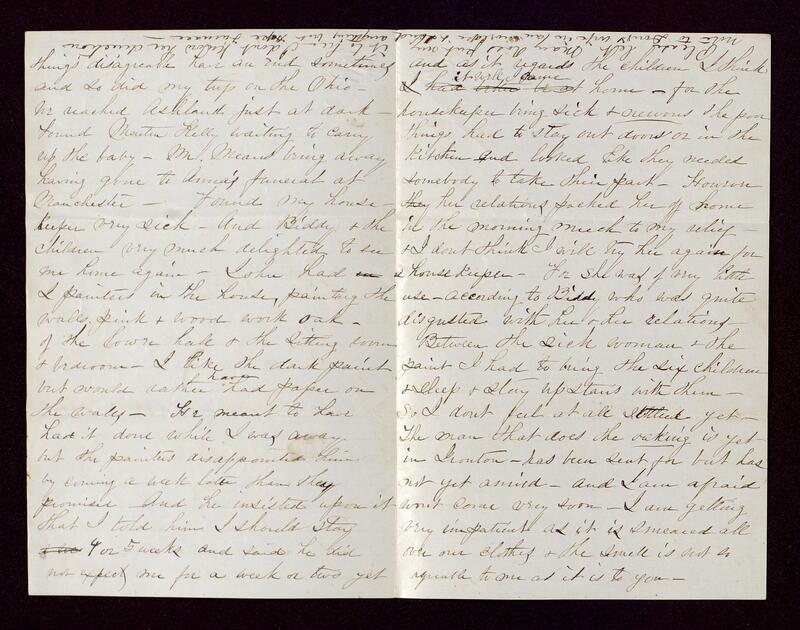 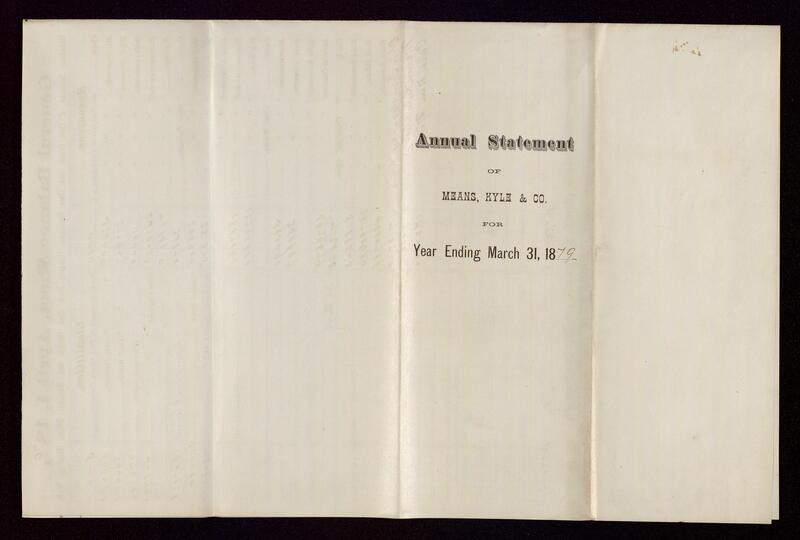 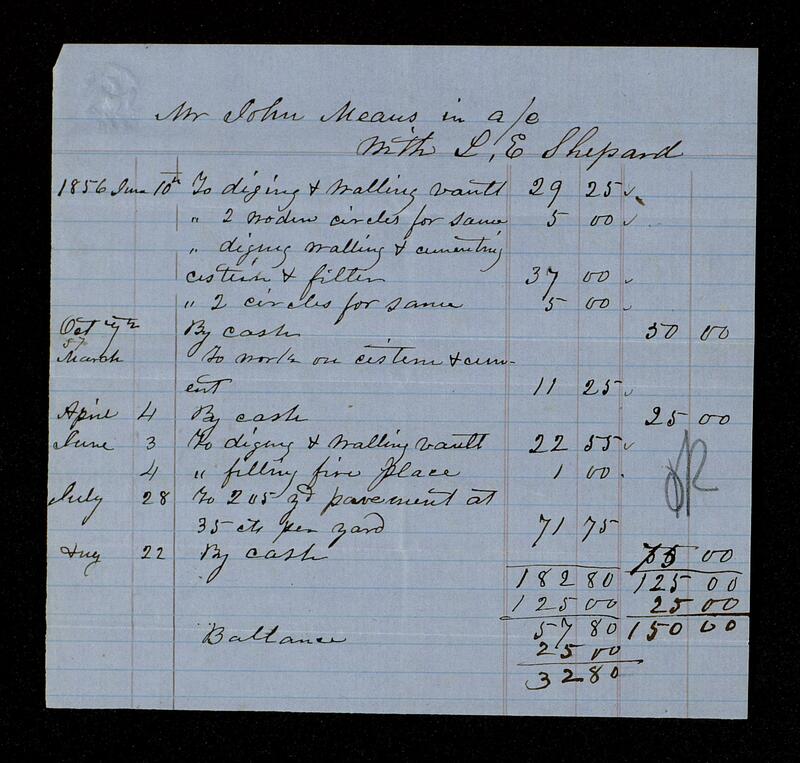 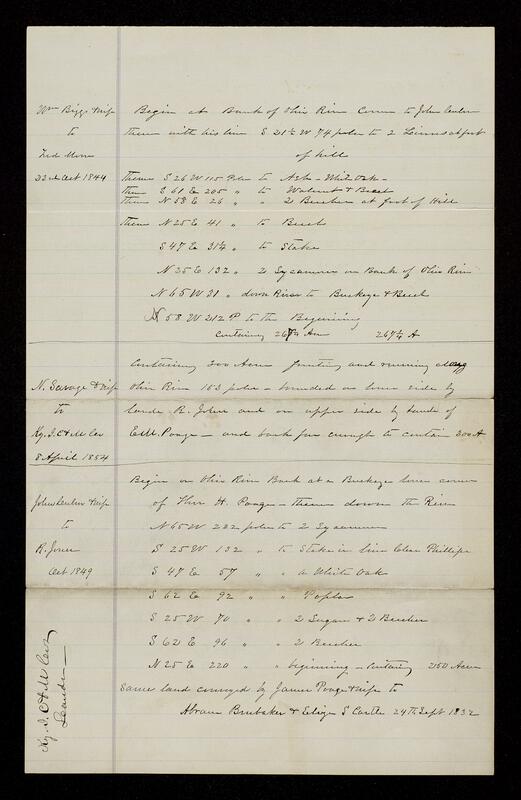 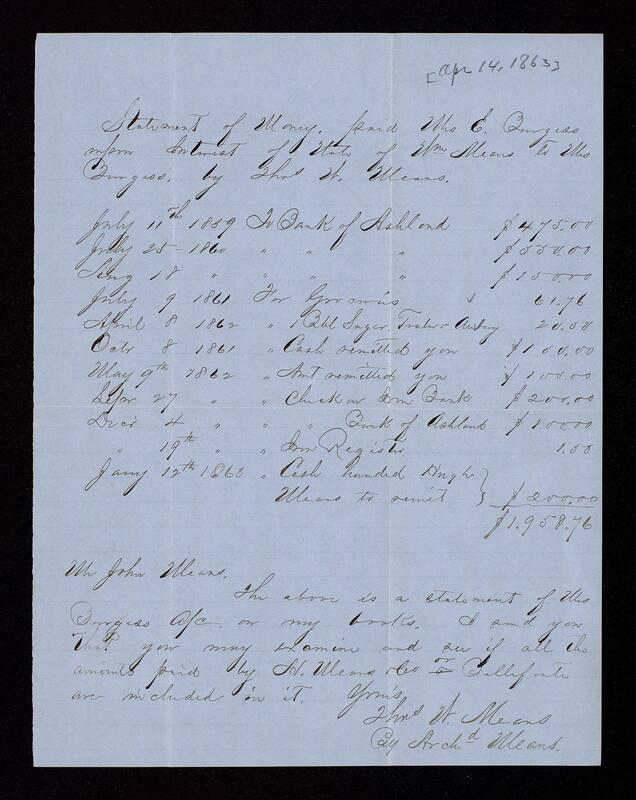 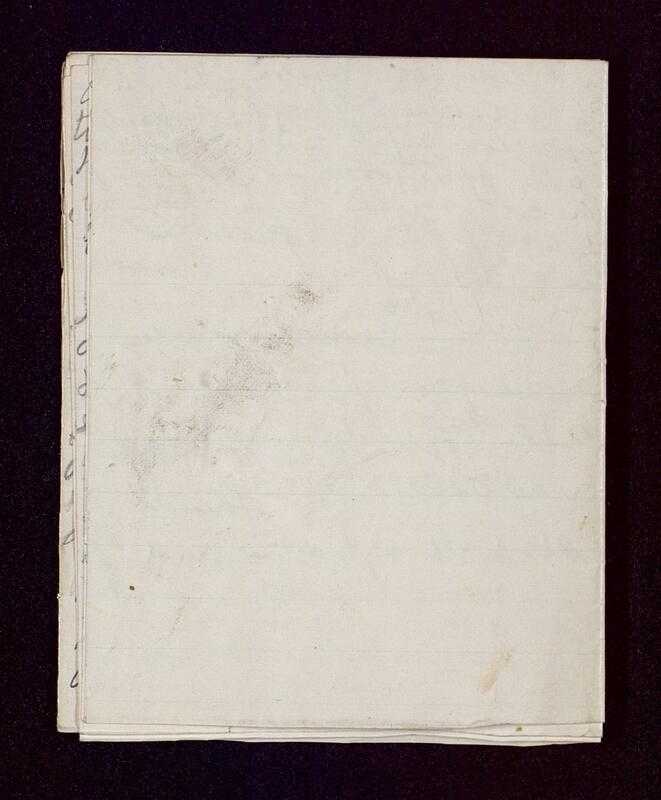 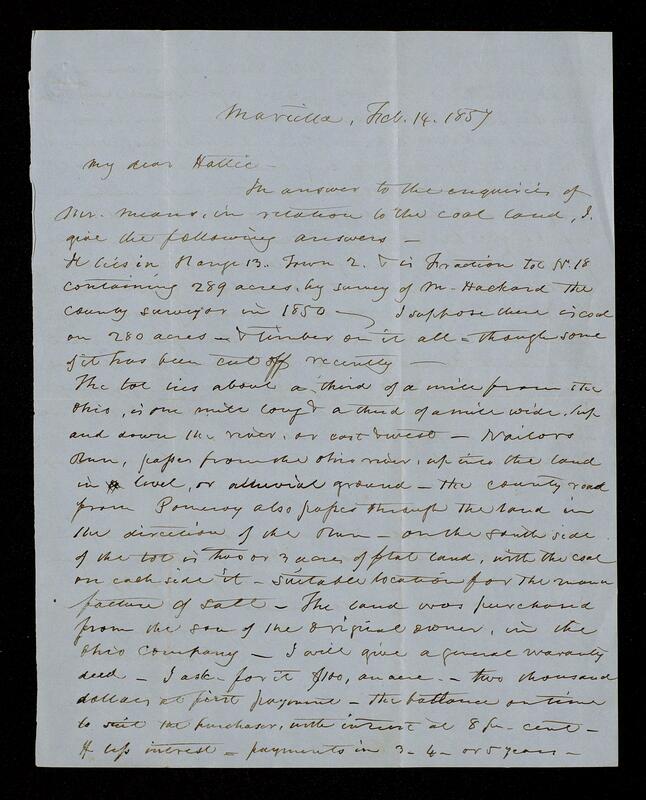 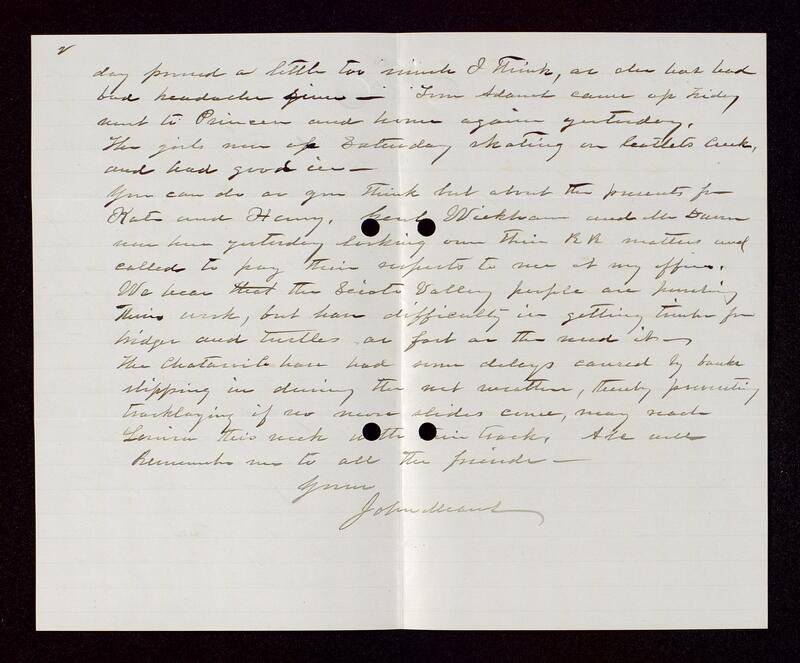 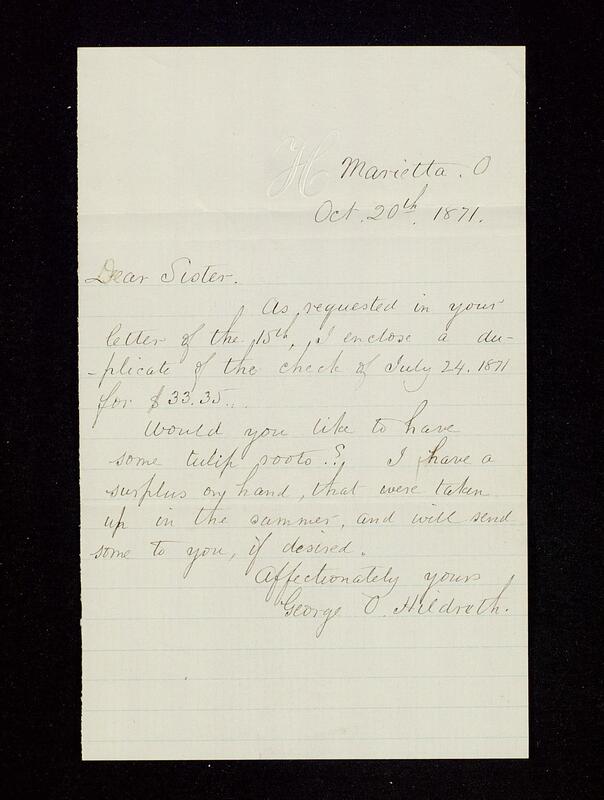 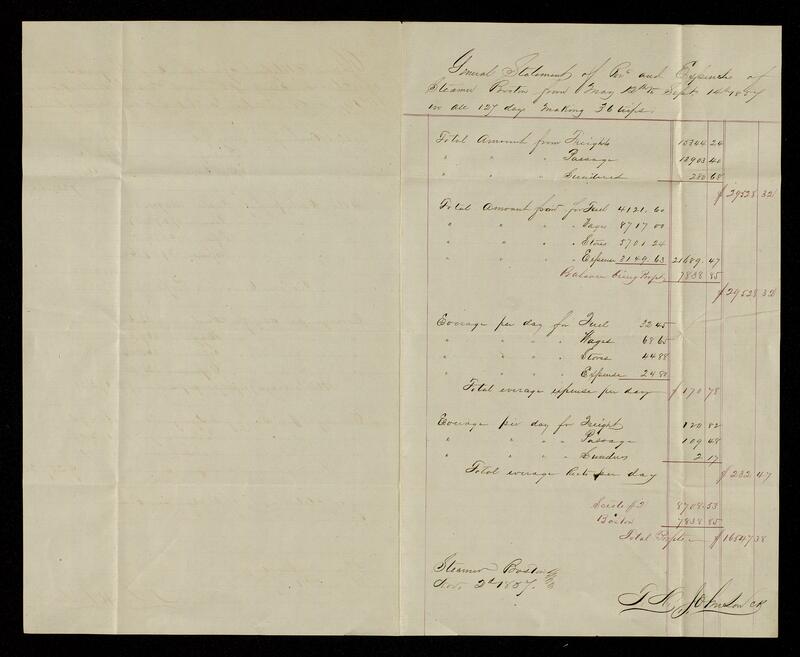 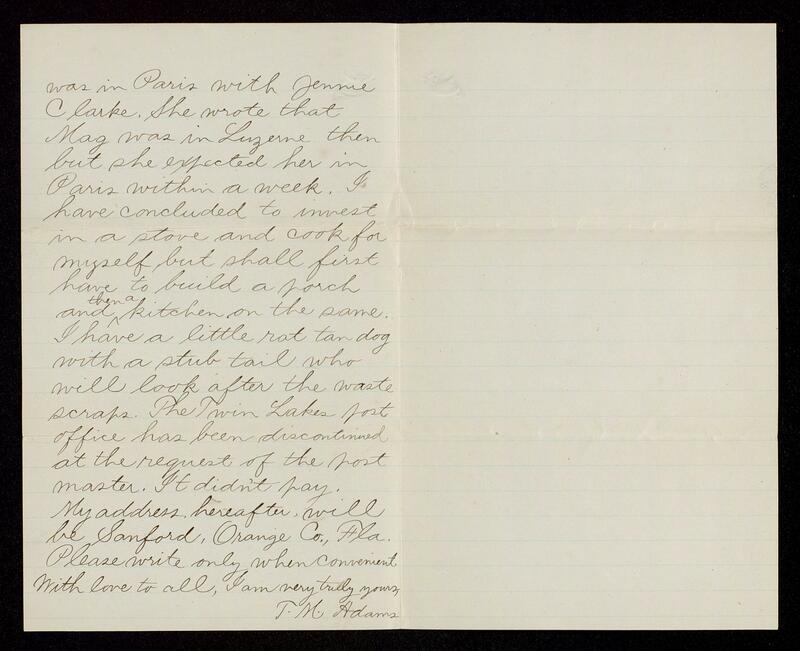 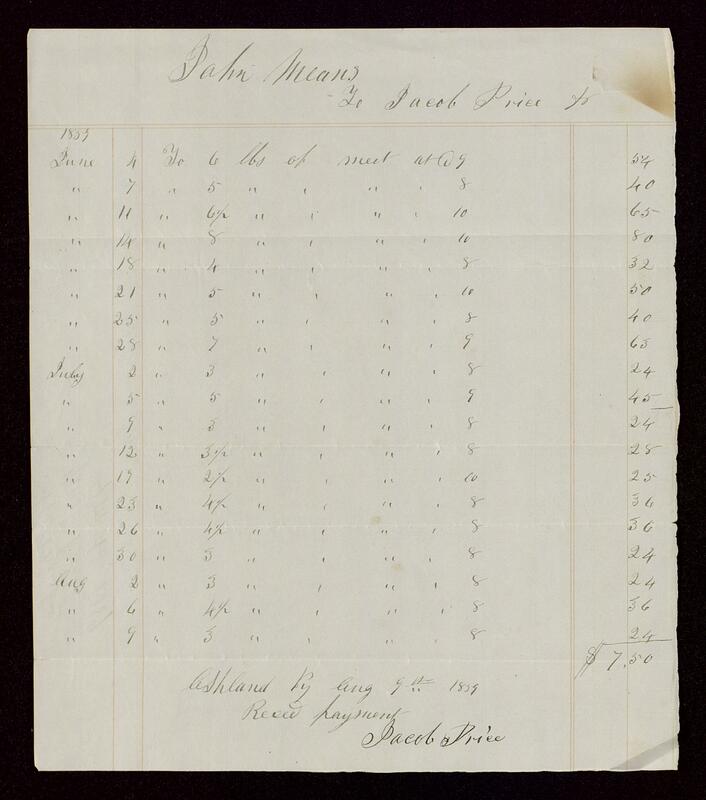 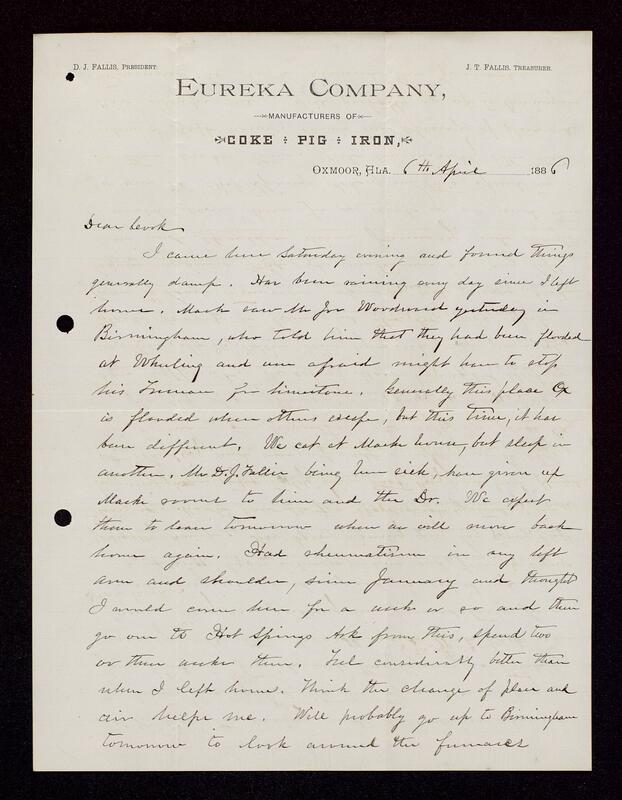 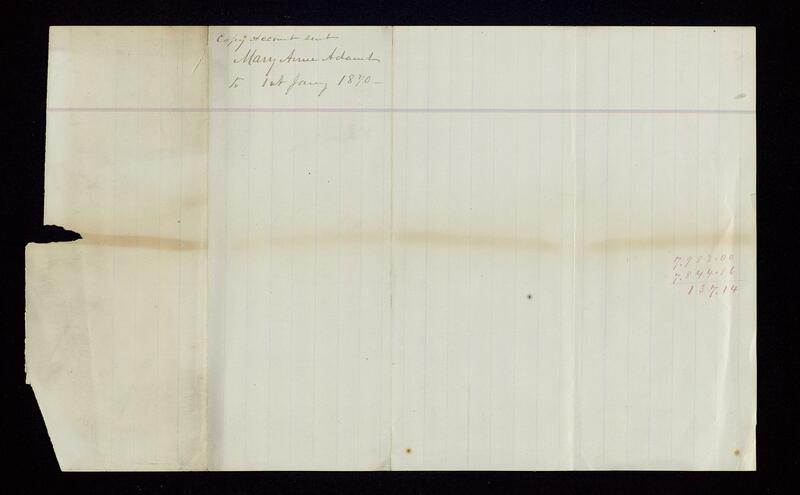 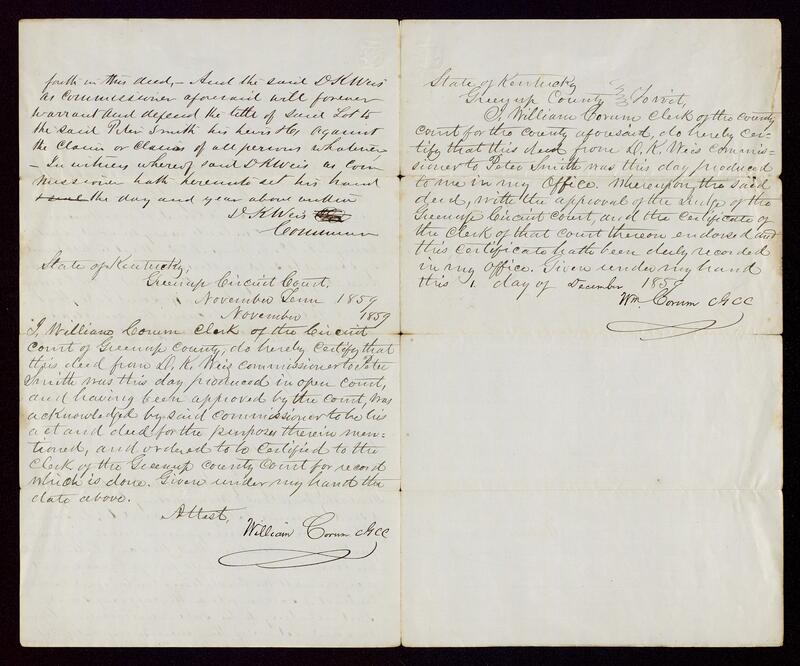 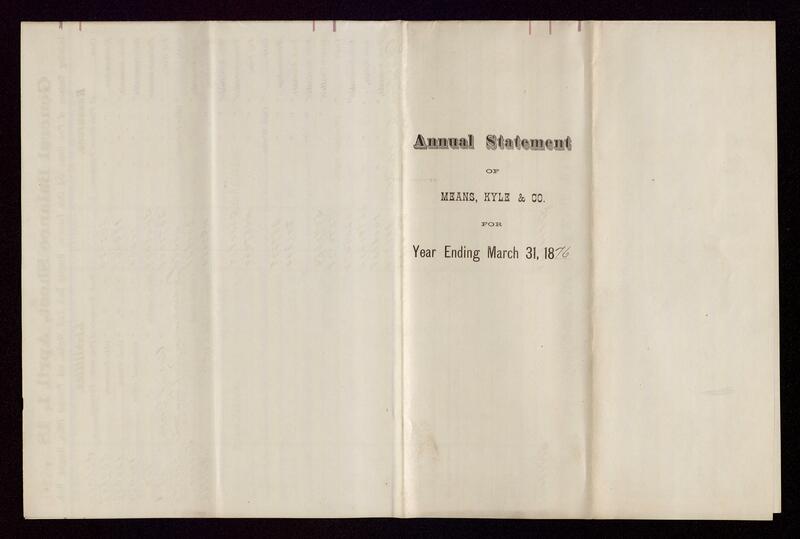 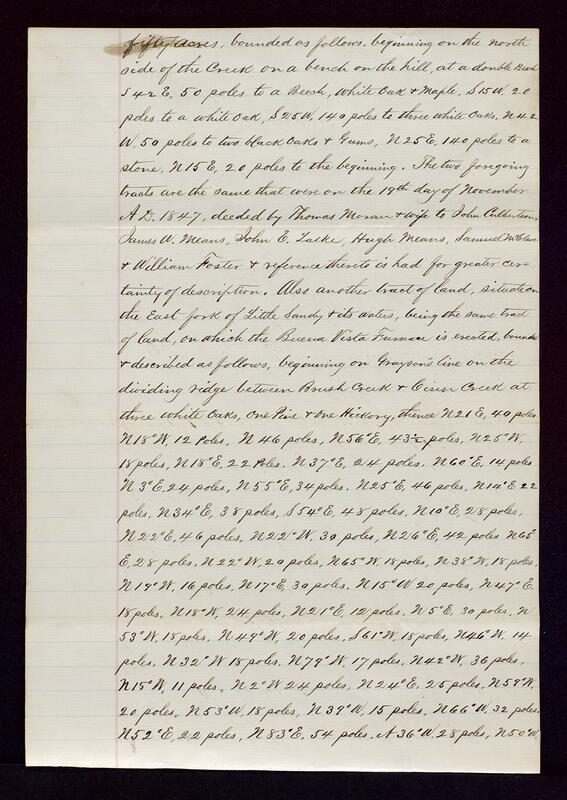 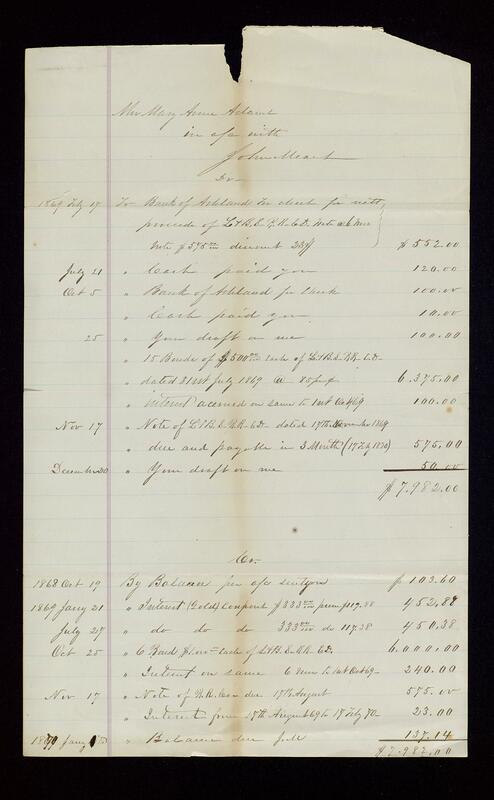 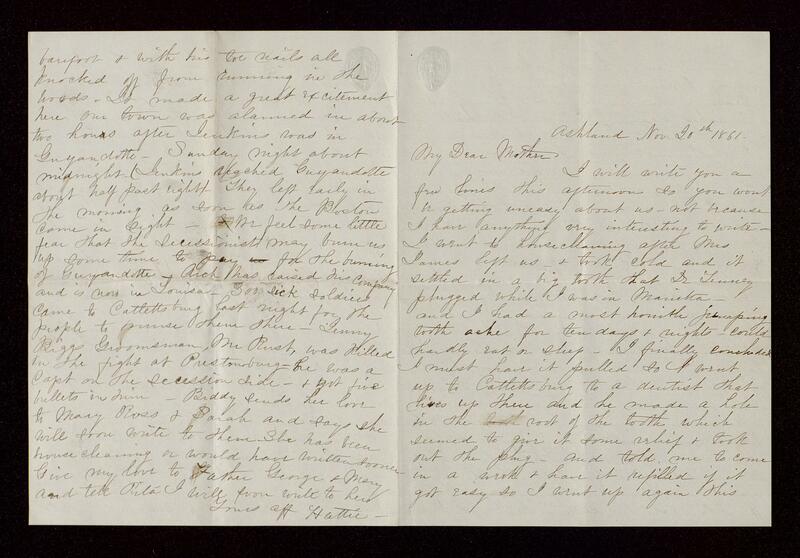 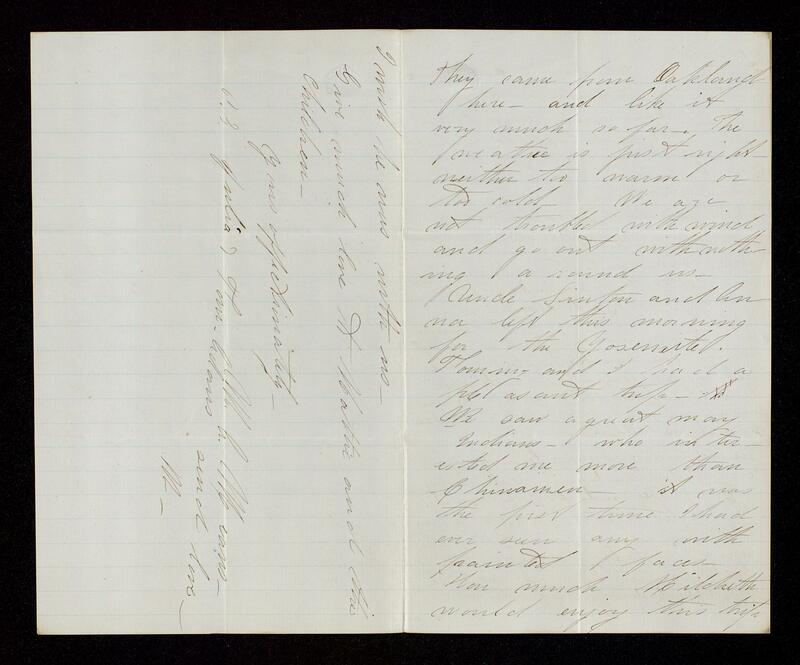 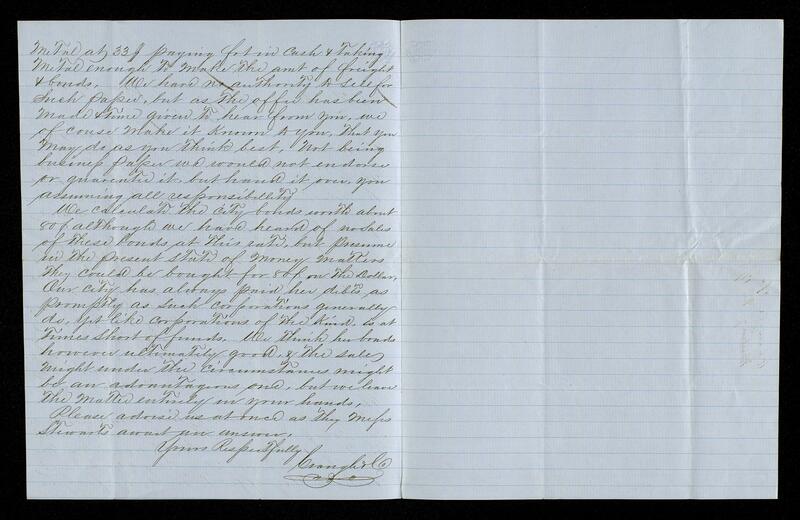 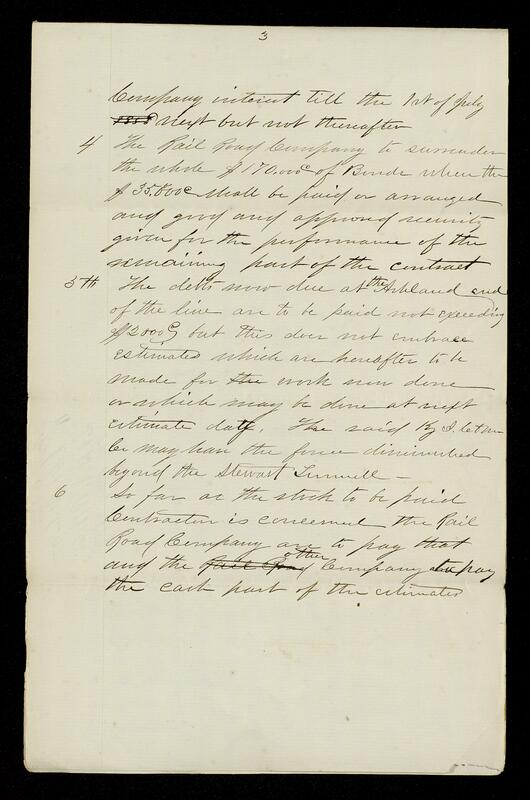 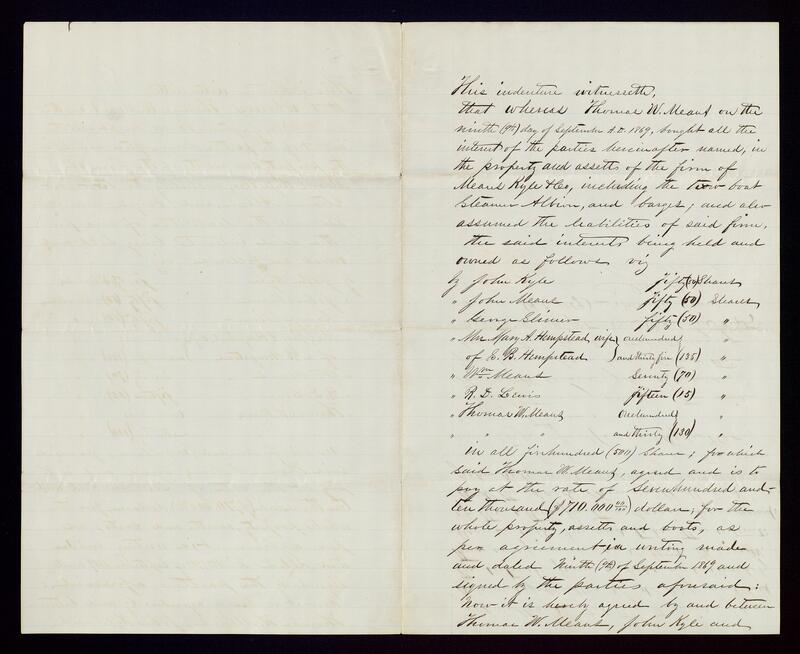 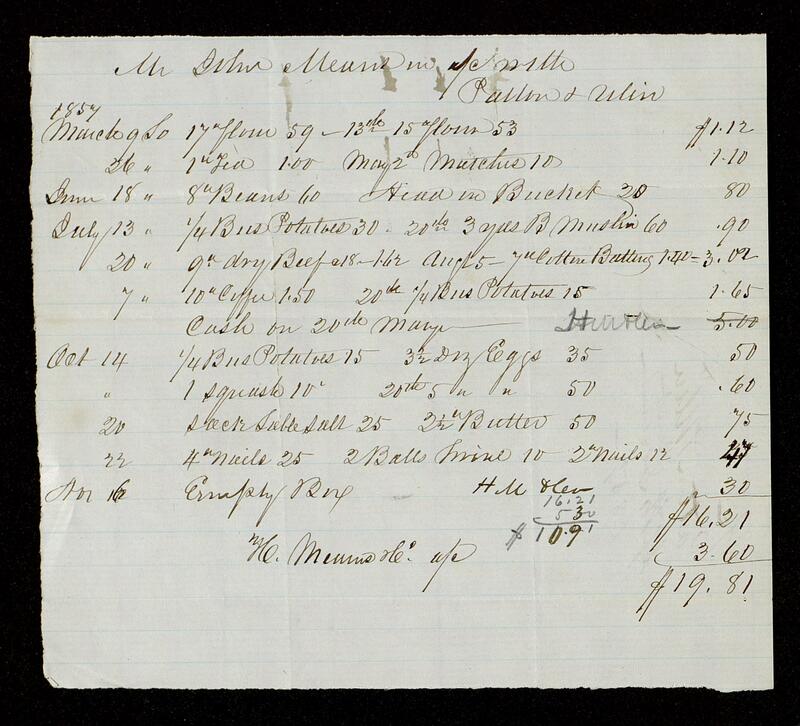 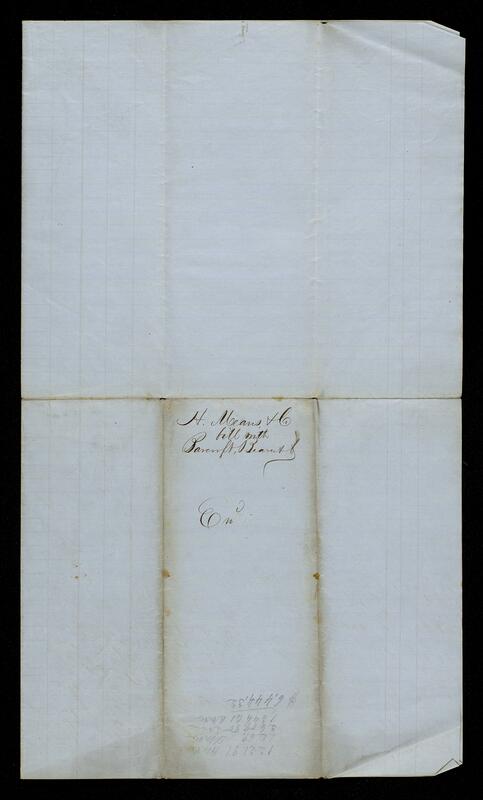 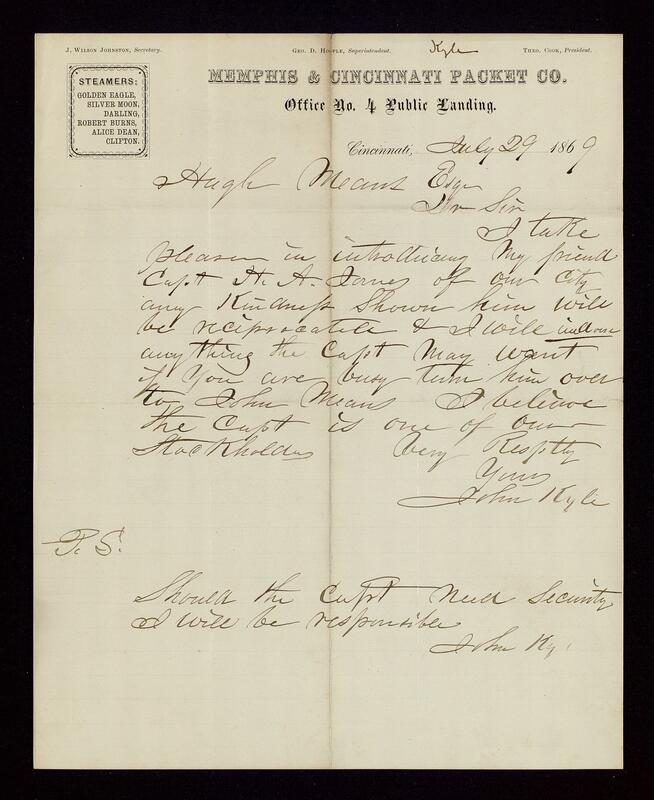 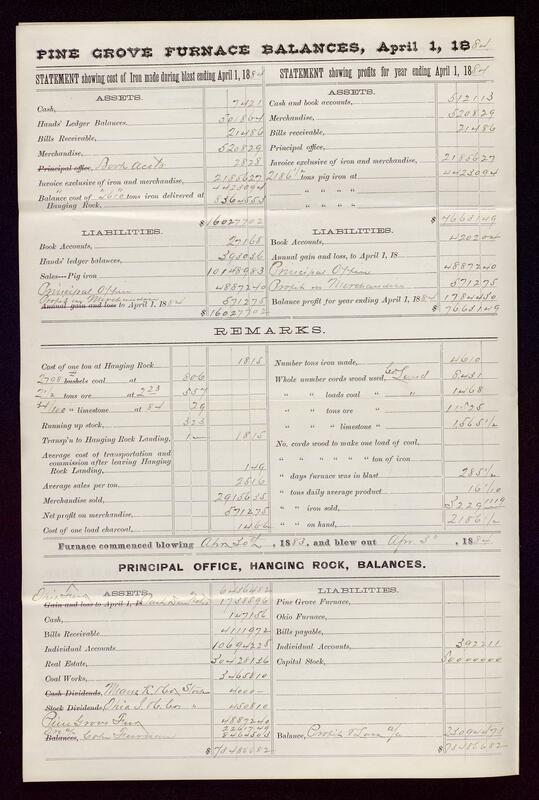 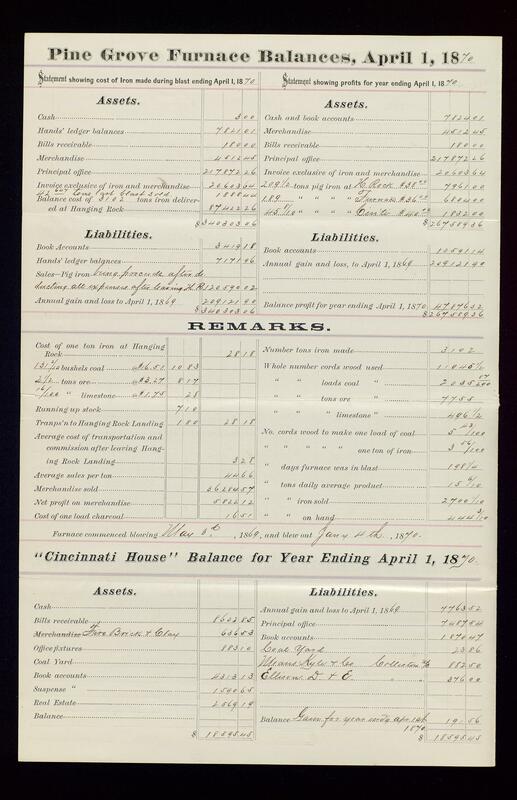 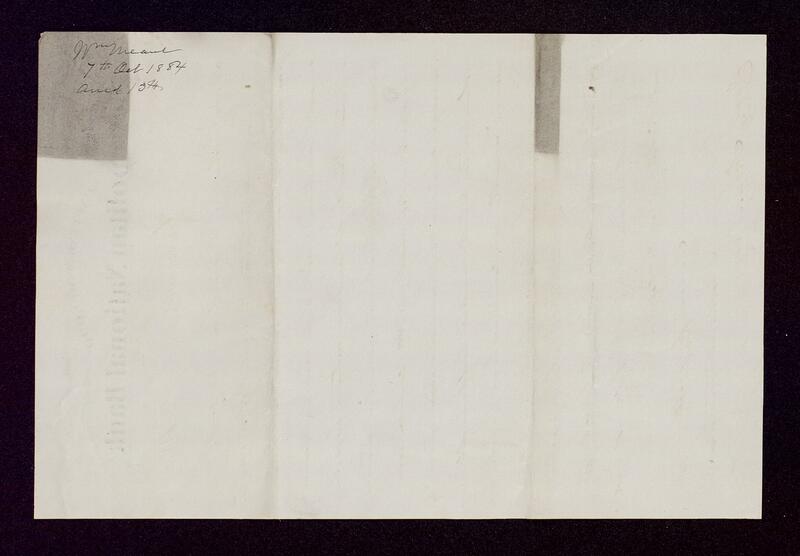 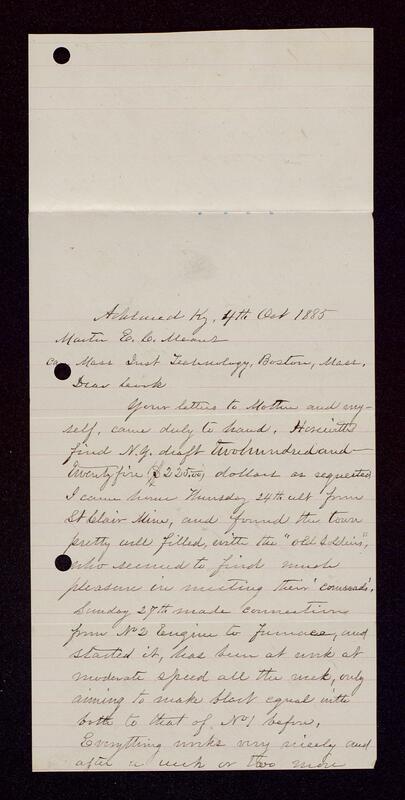 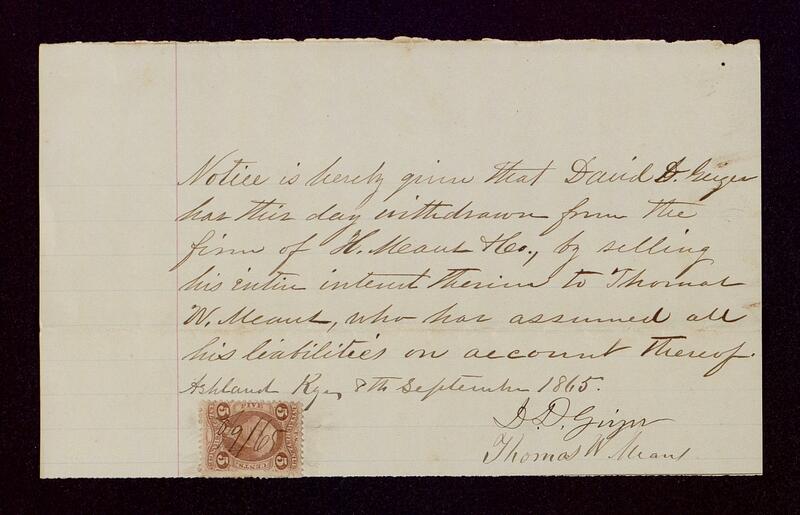 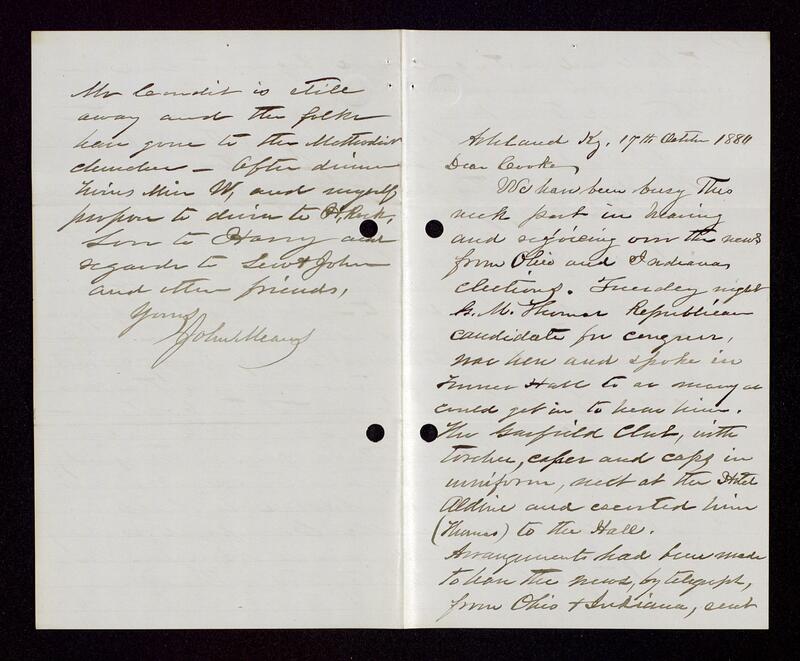 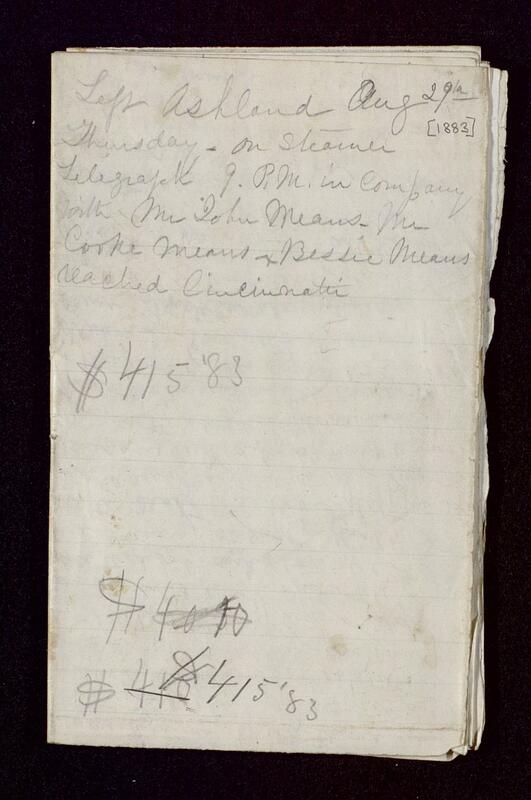 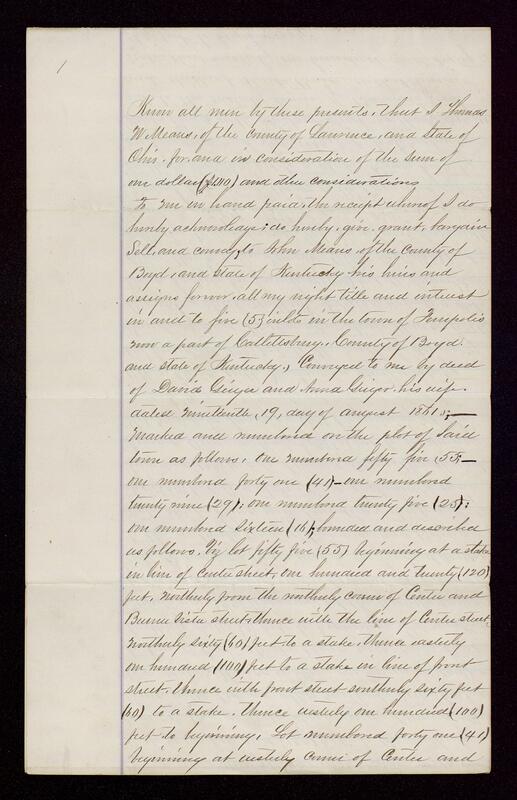 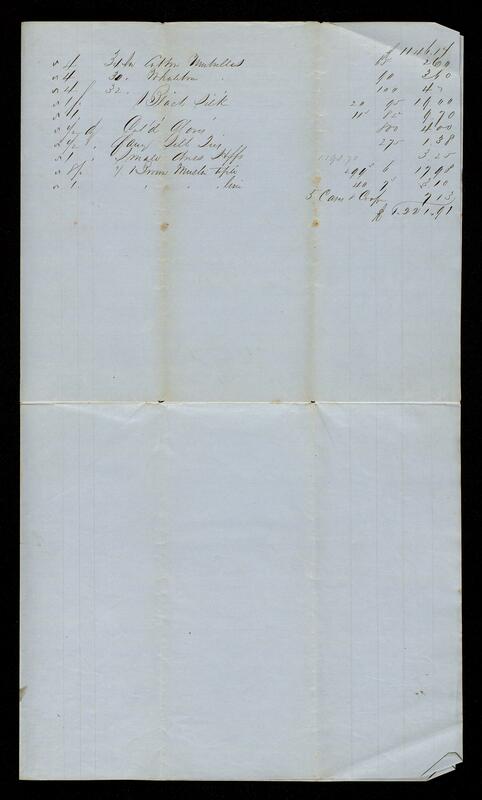 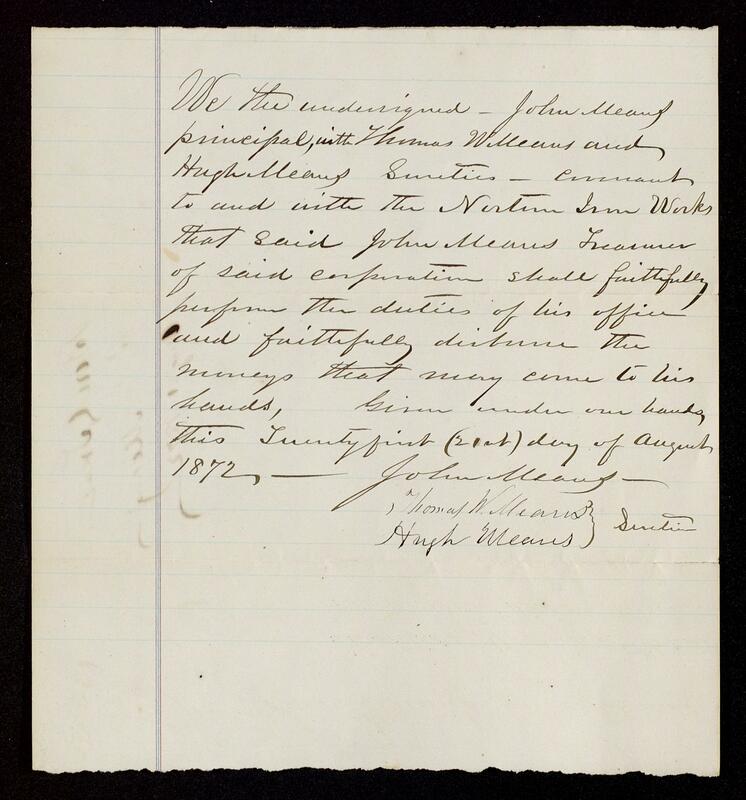 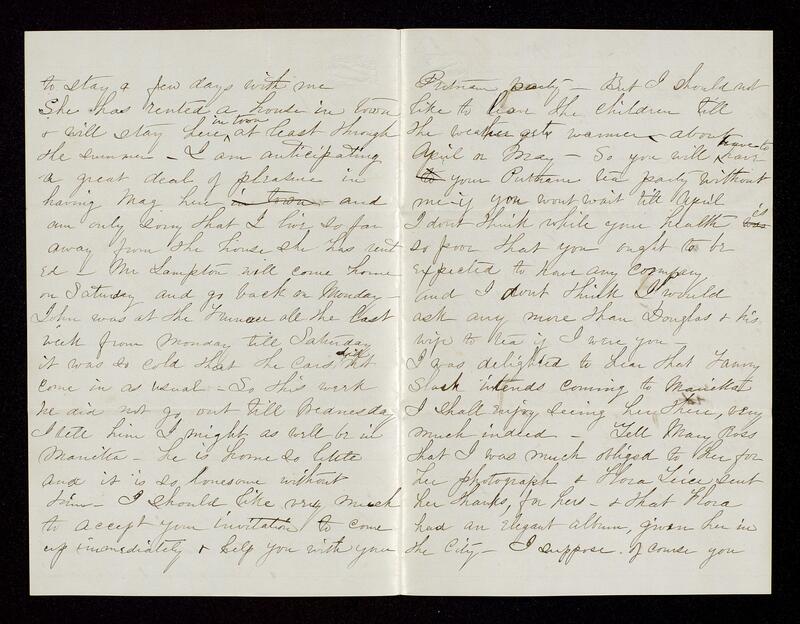 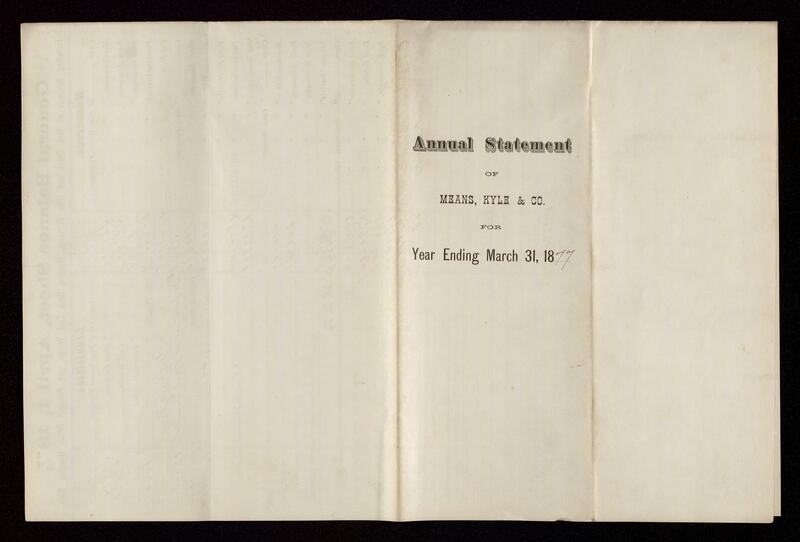 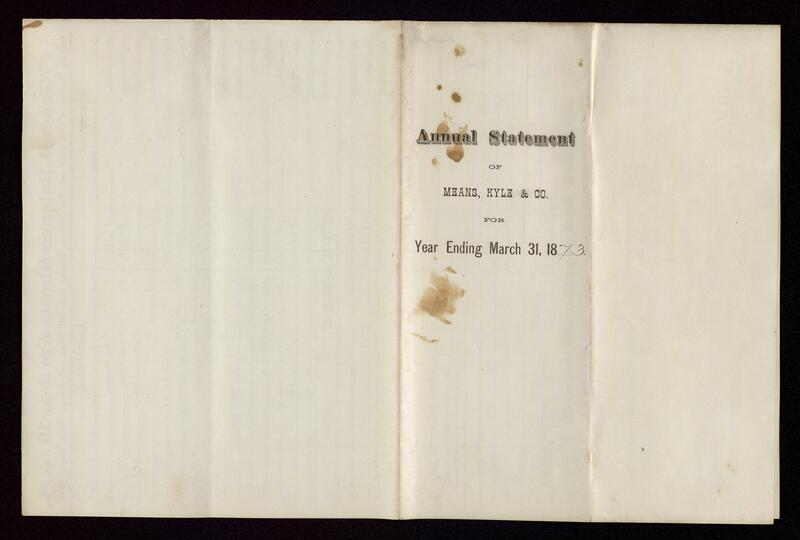 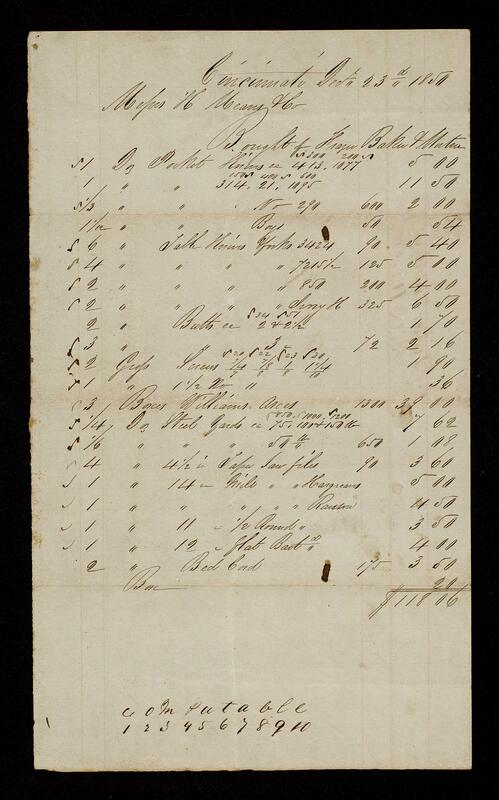 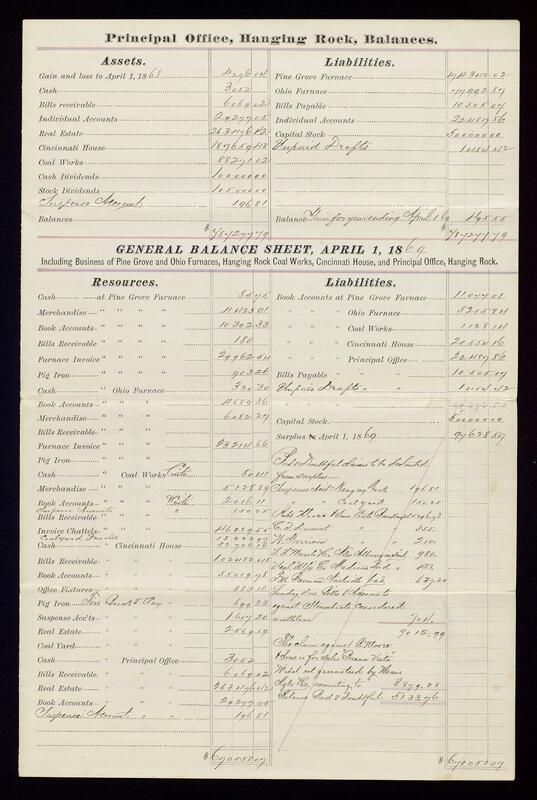 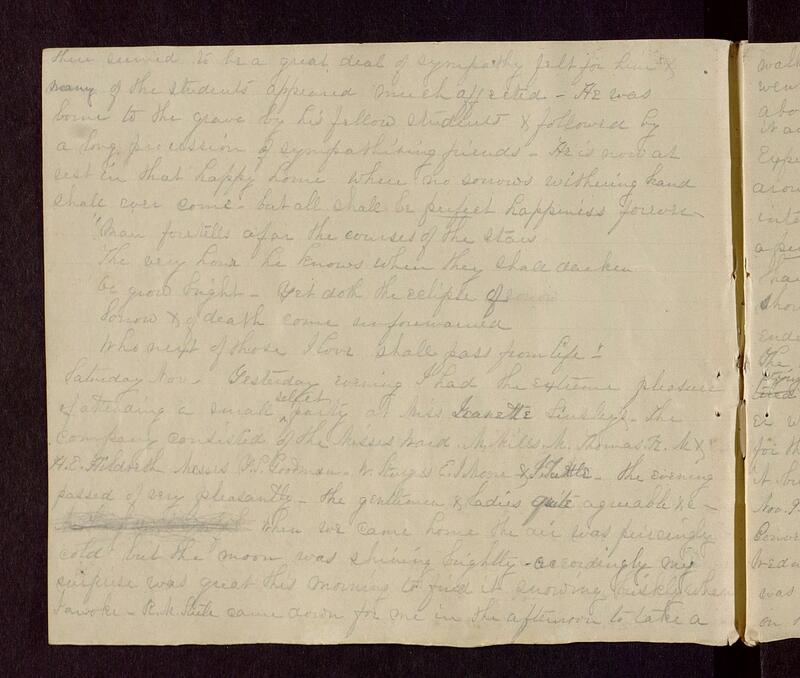 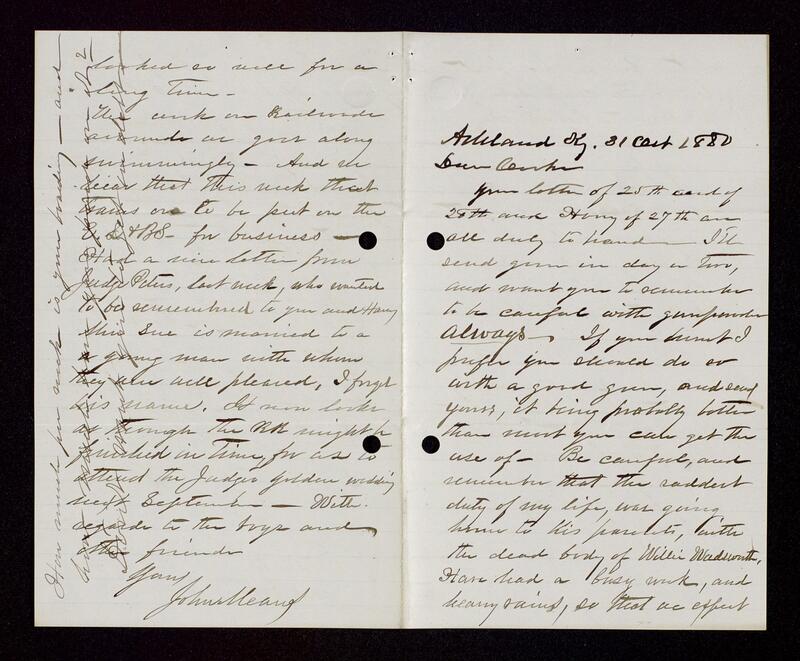 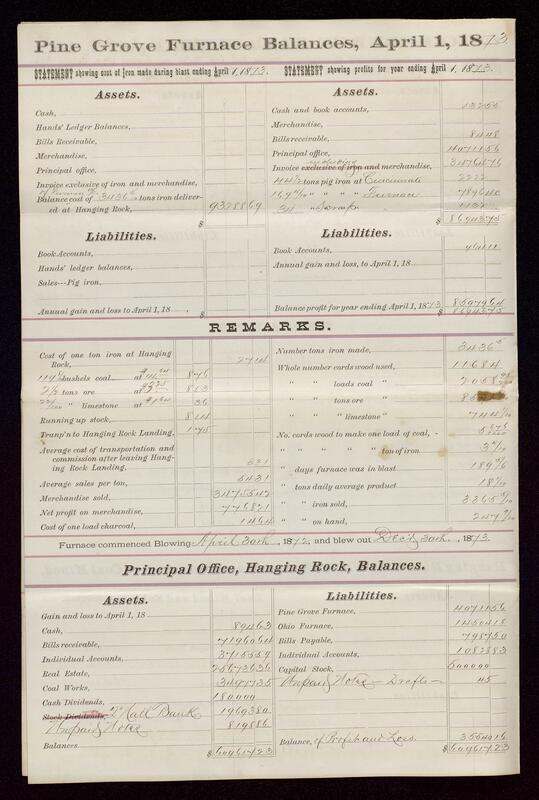 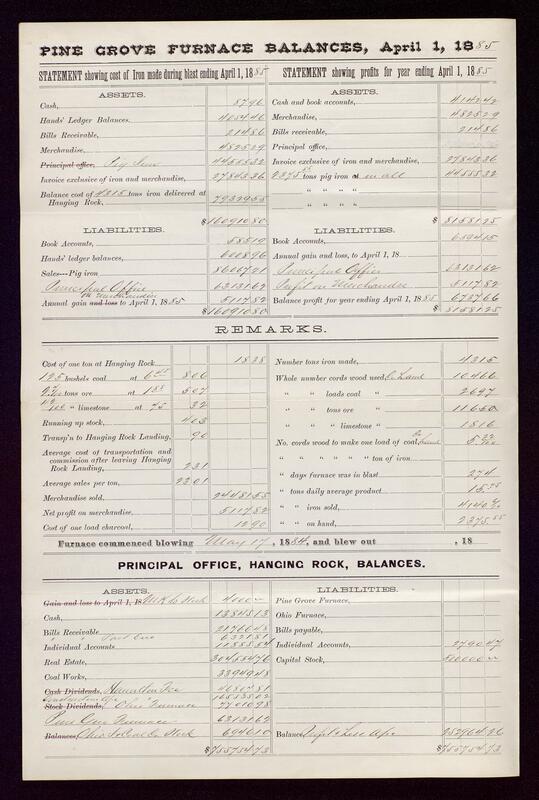 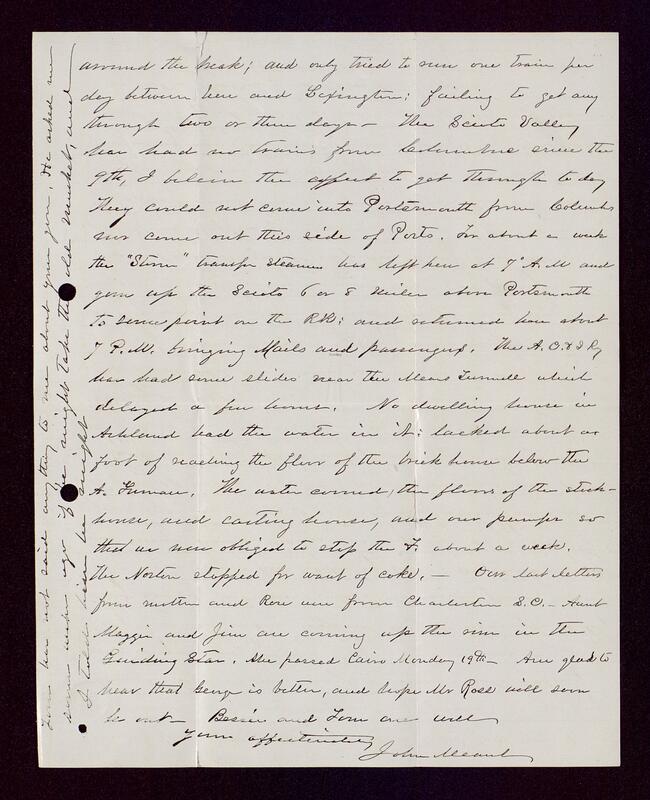 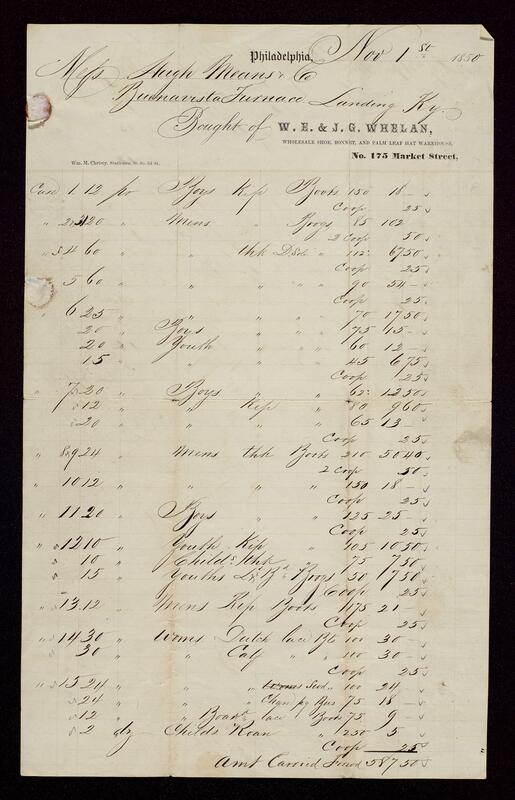 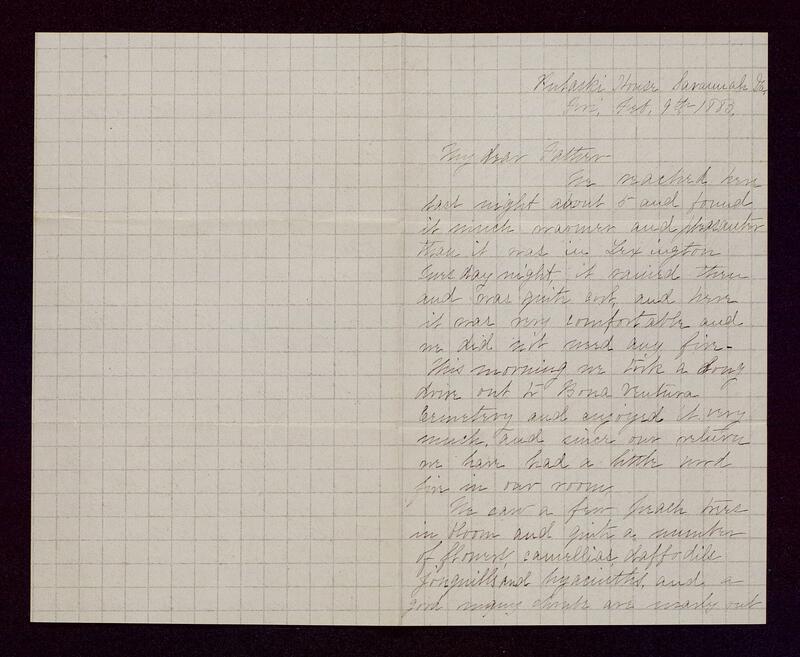 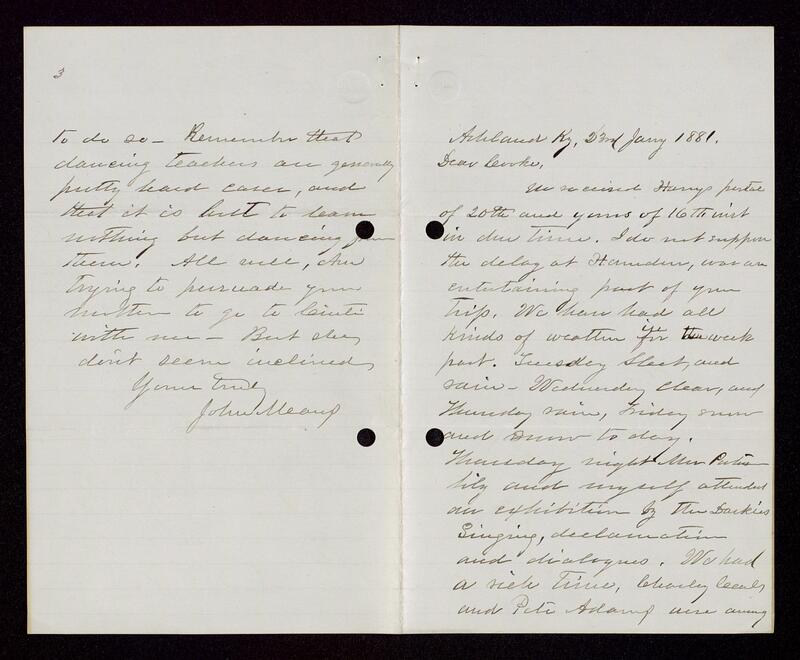 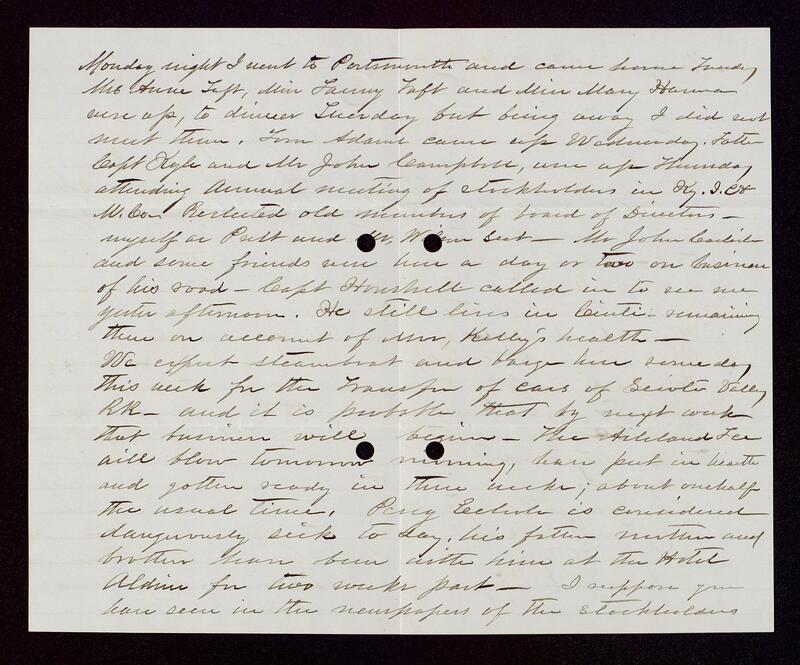 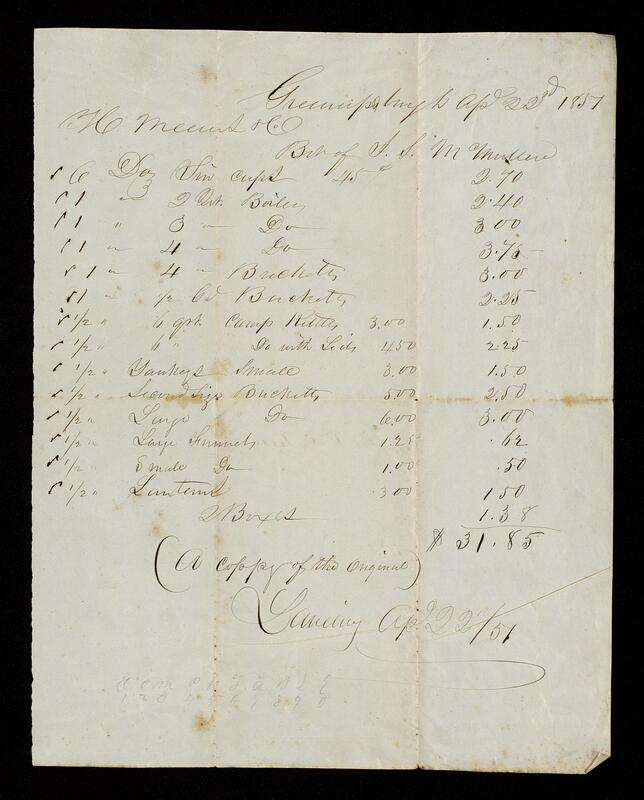 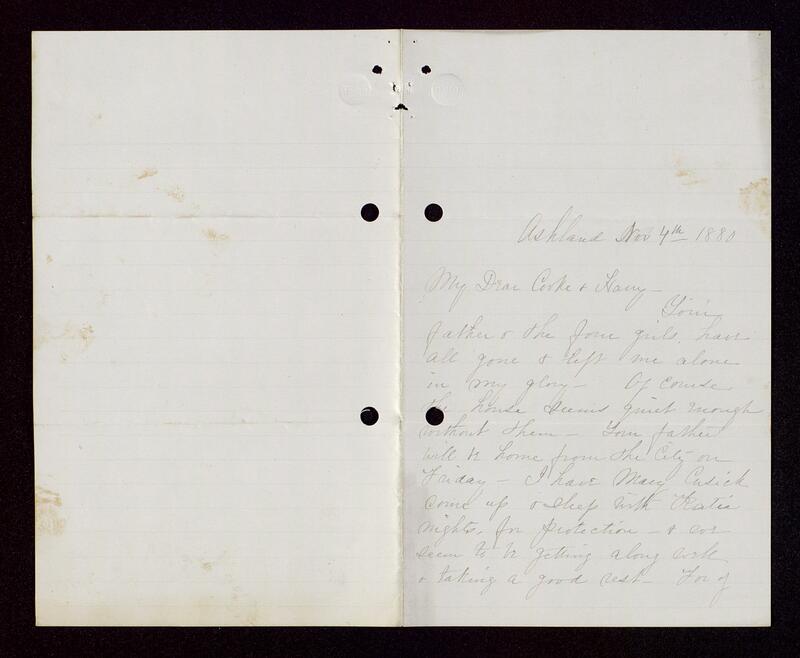 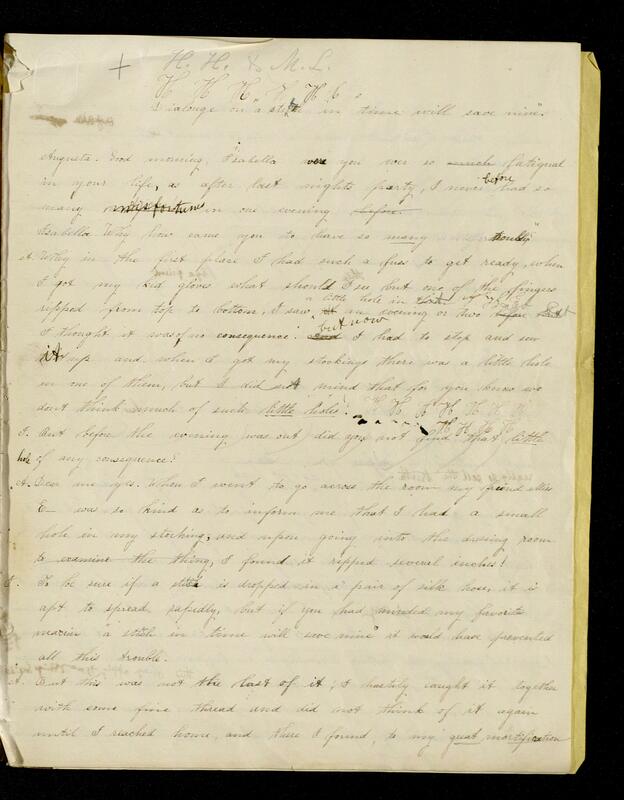 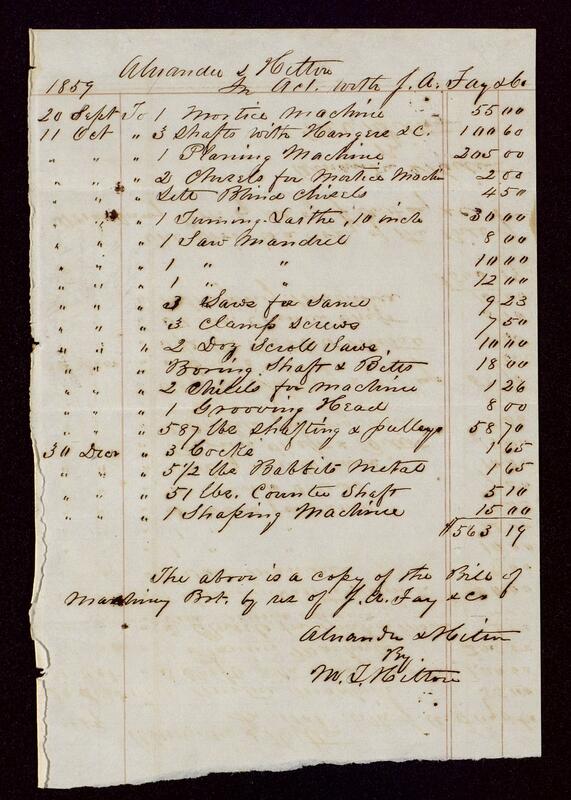 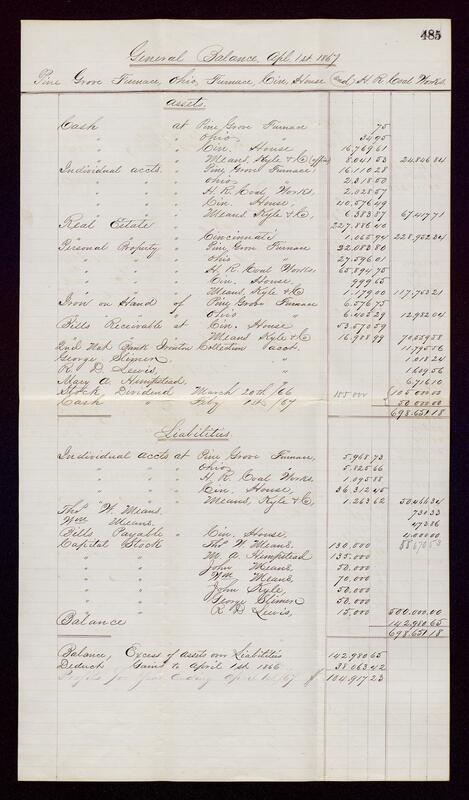 Included here is more personal correspondence of Harriet Means; business correspondence of John Means concerning work at Buena Vista Furnace and the formation of the Kentucky Iron, Coal and Manufacturing Company; and miscellaneous financial records. 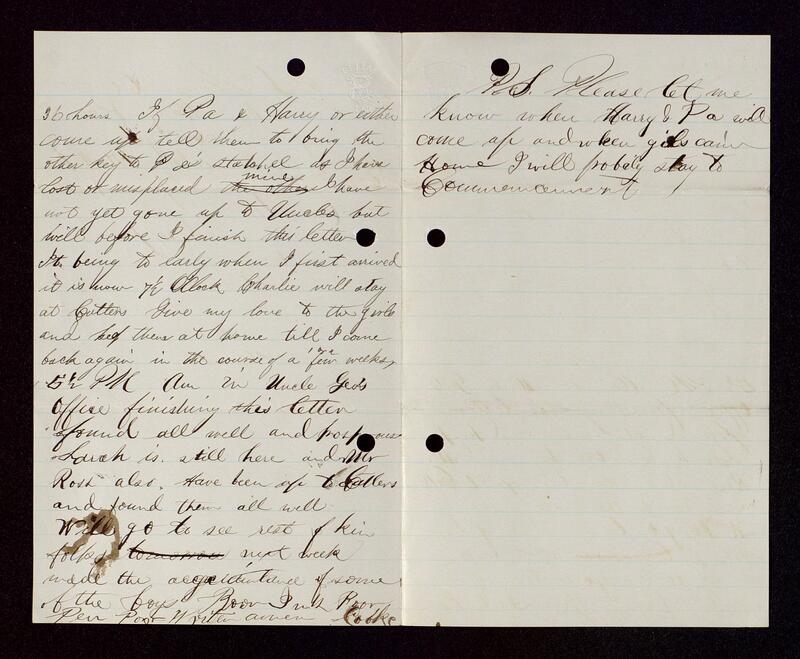 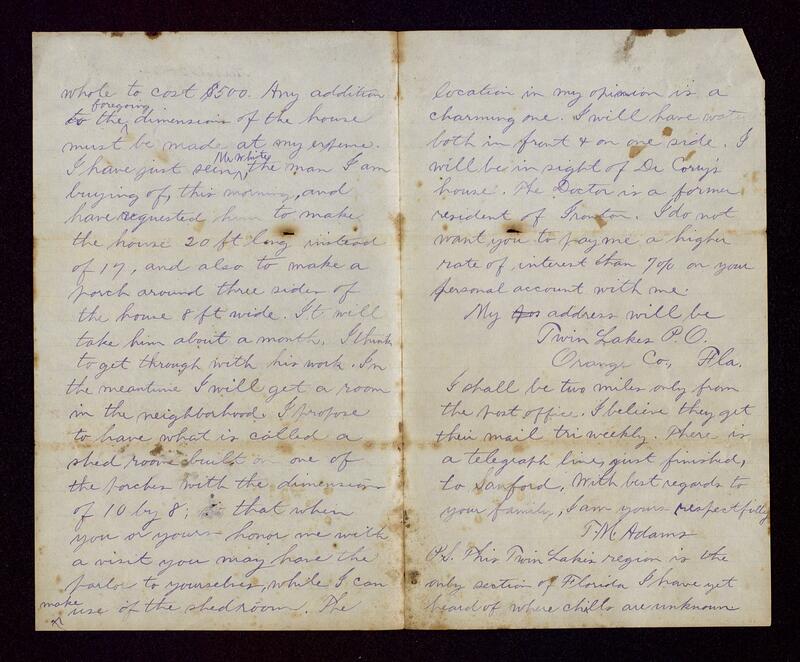 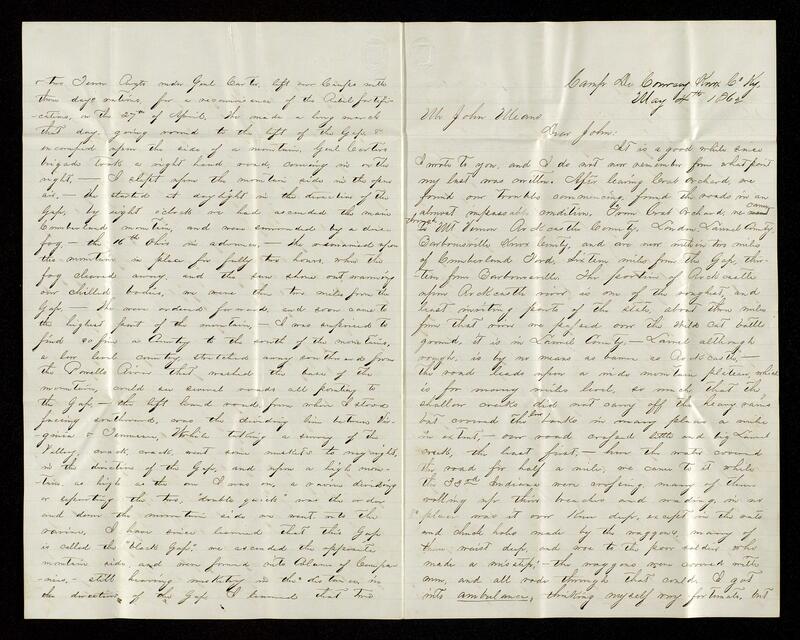 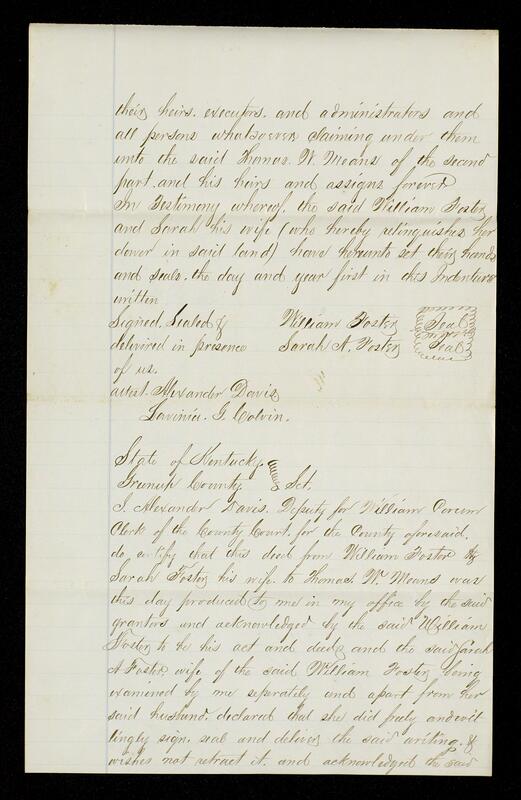 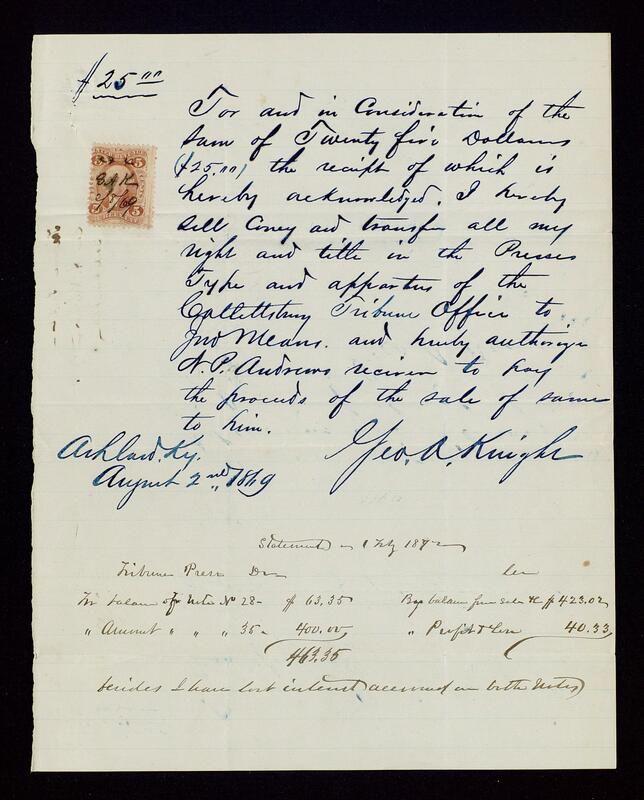 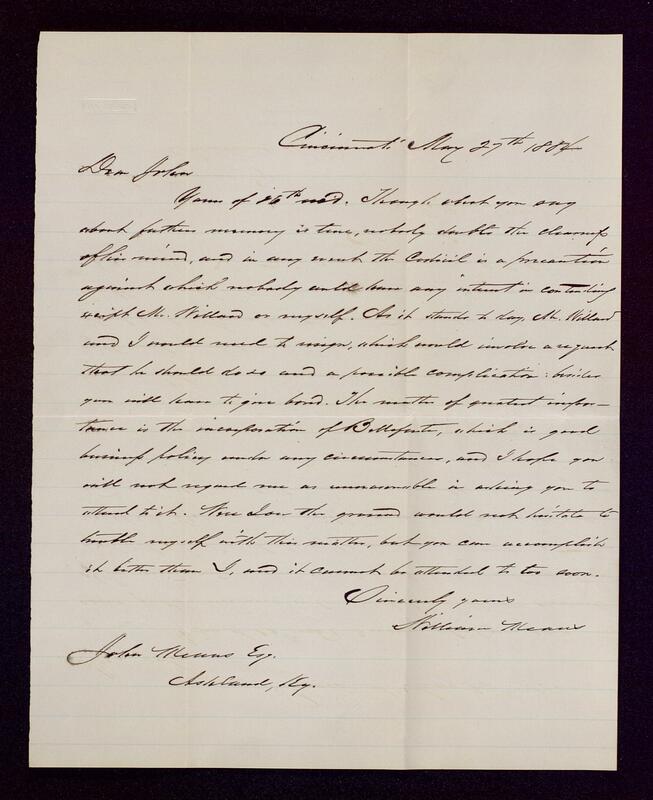 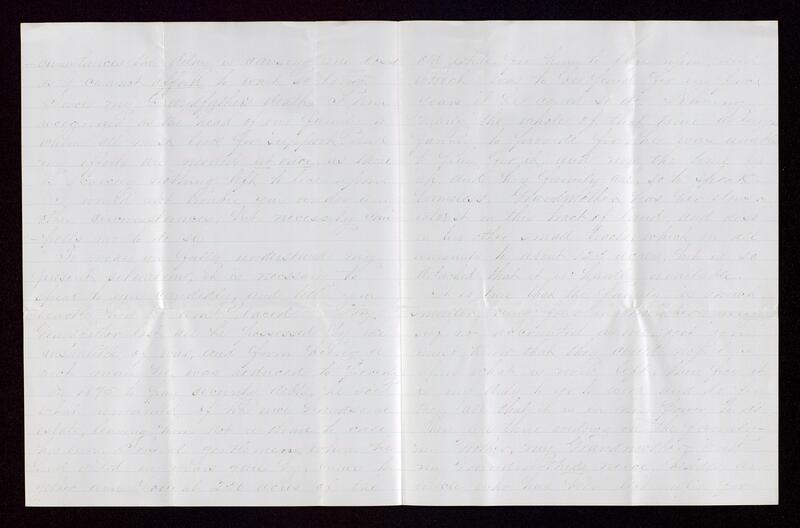 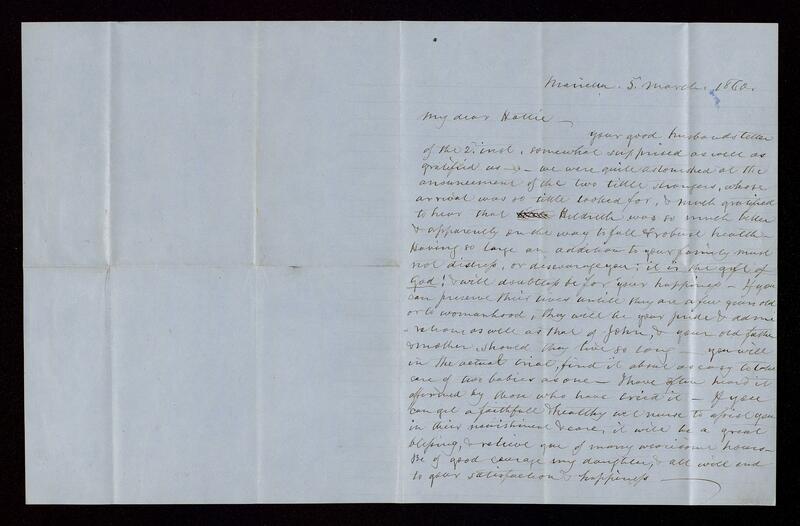 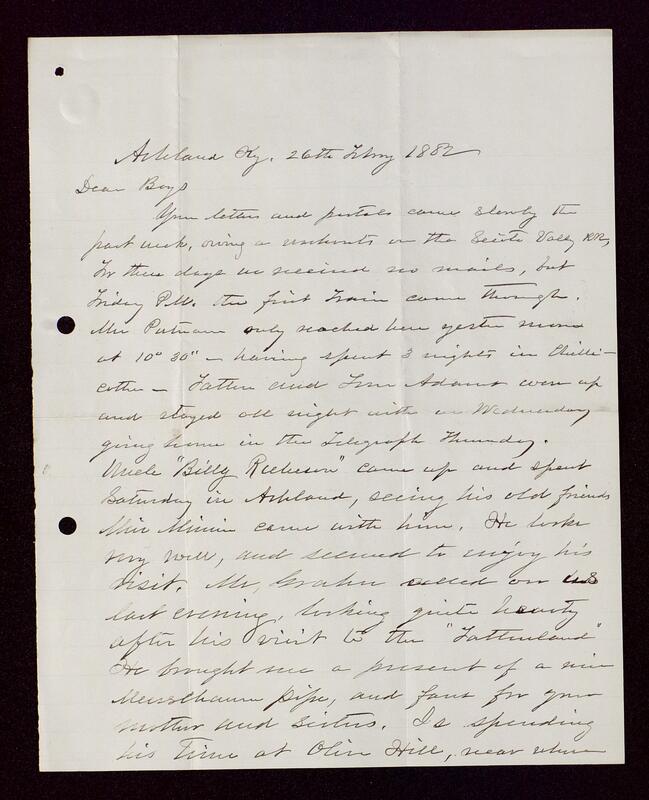 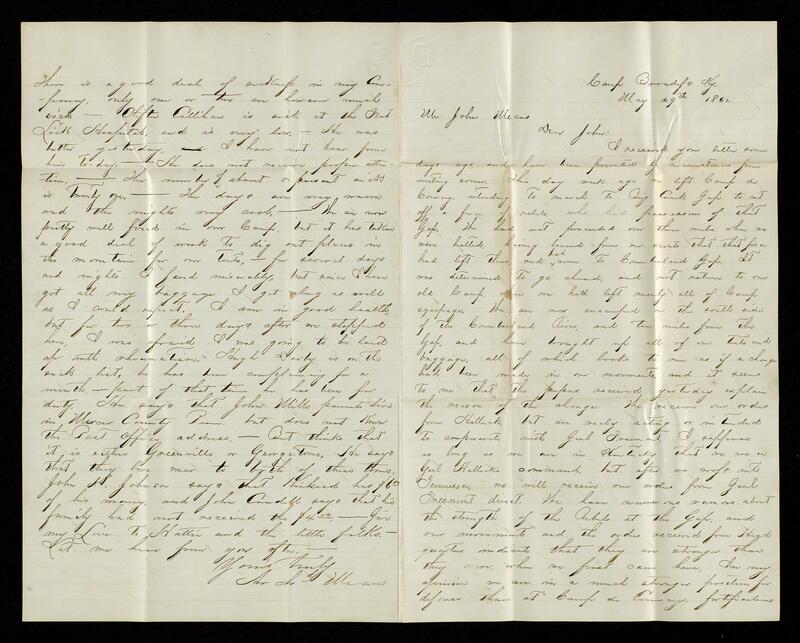 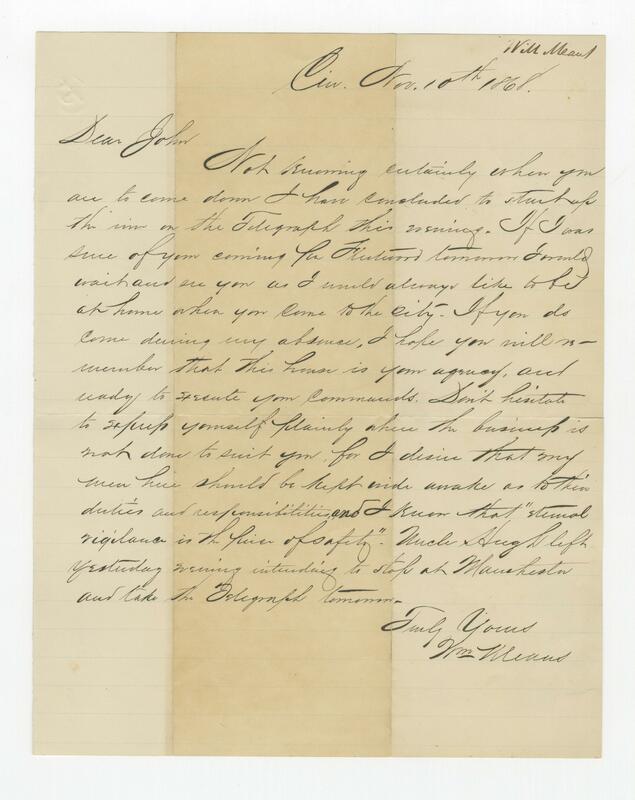 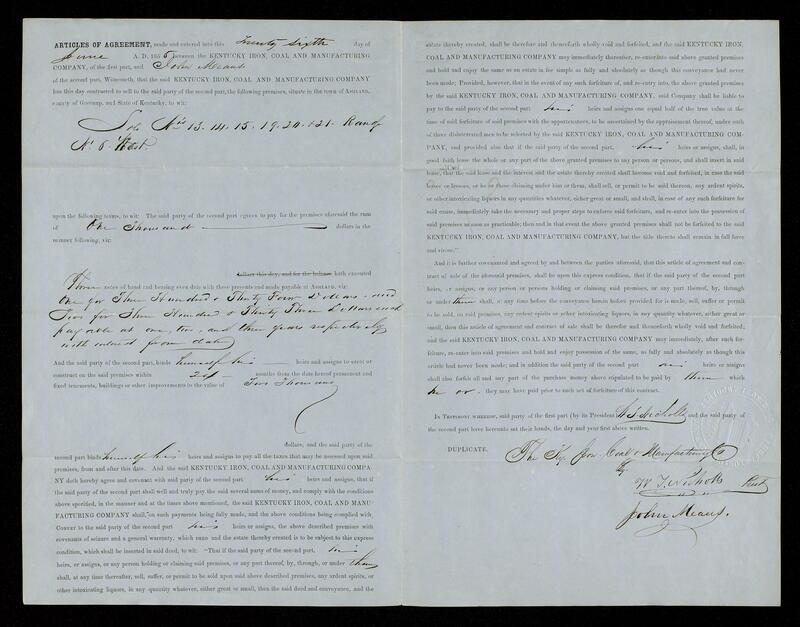 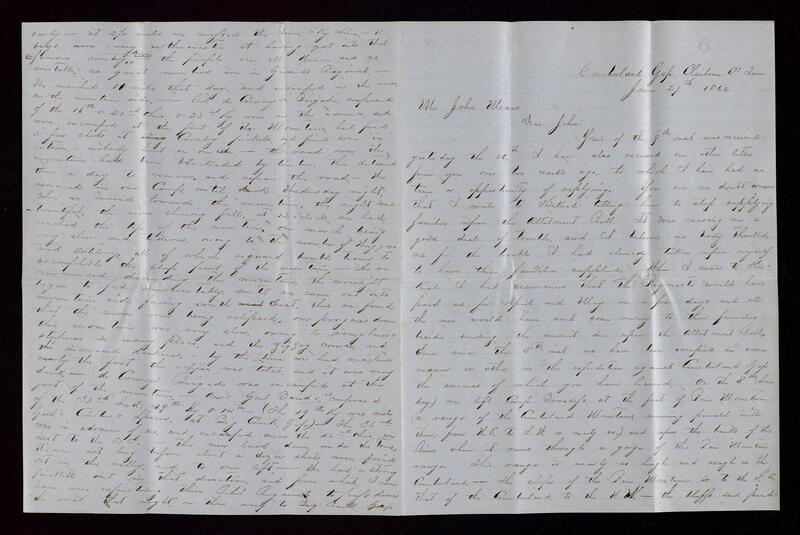 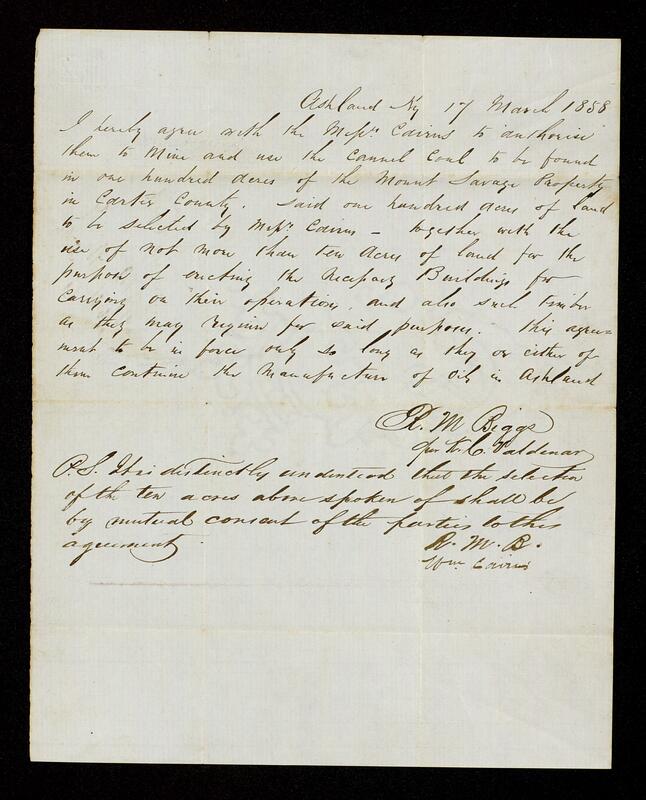 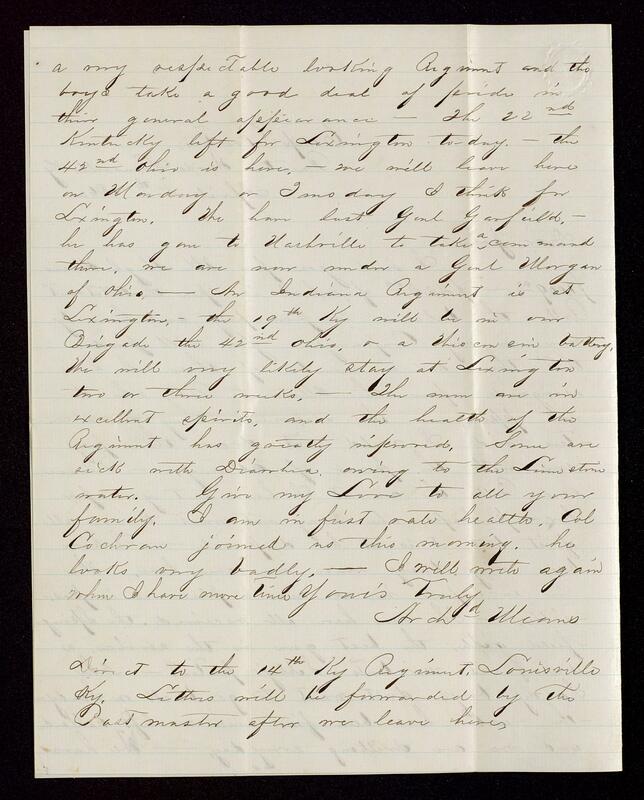 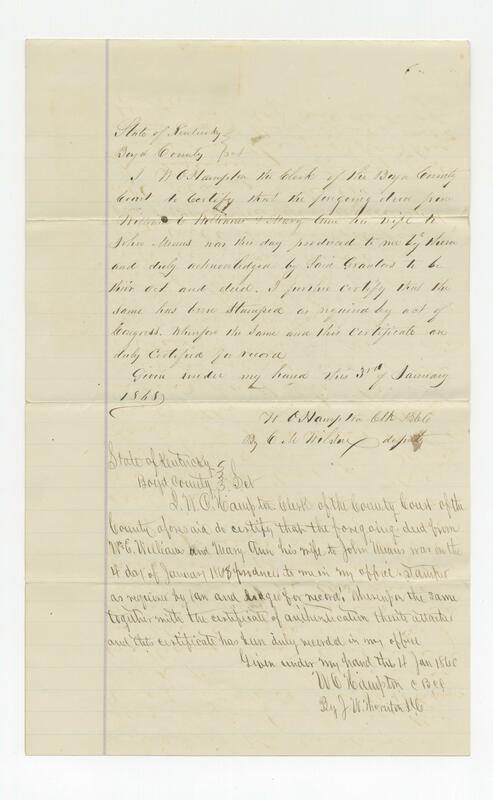 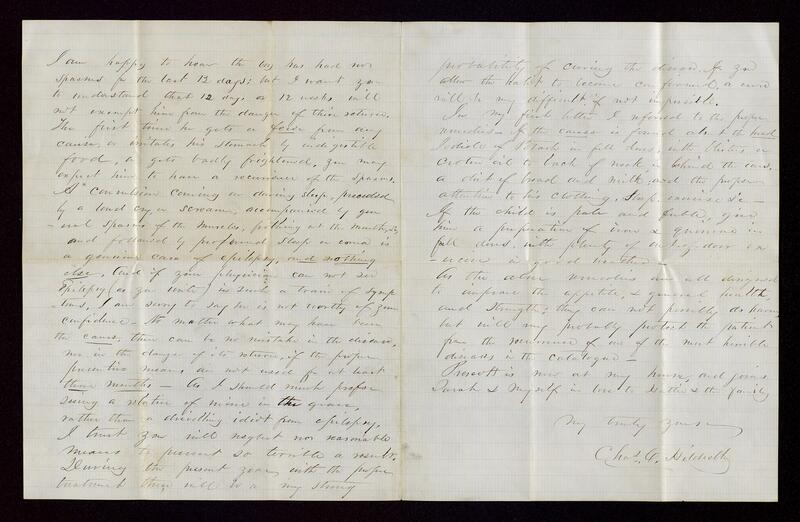 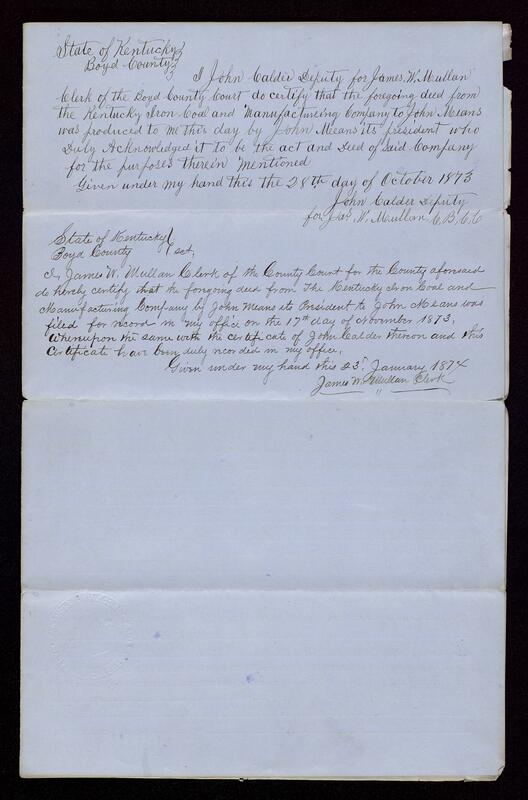 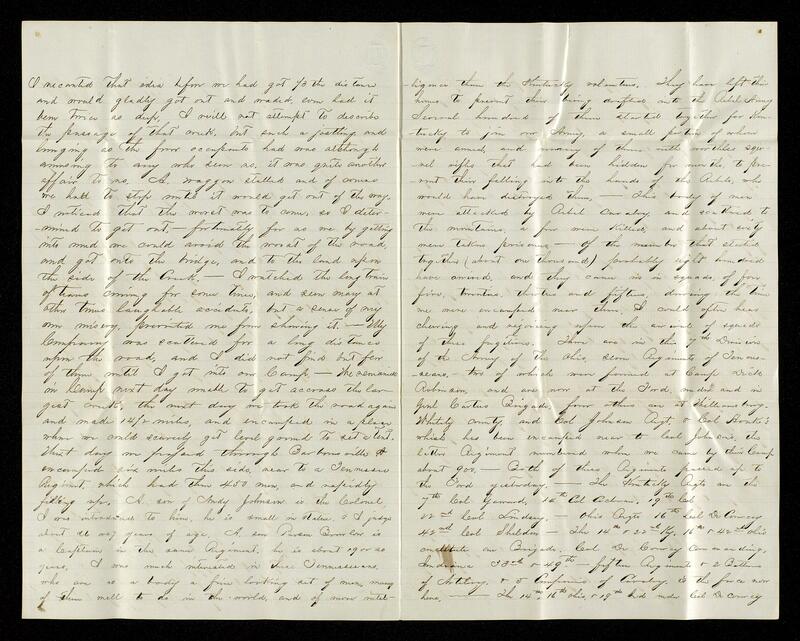 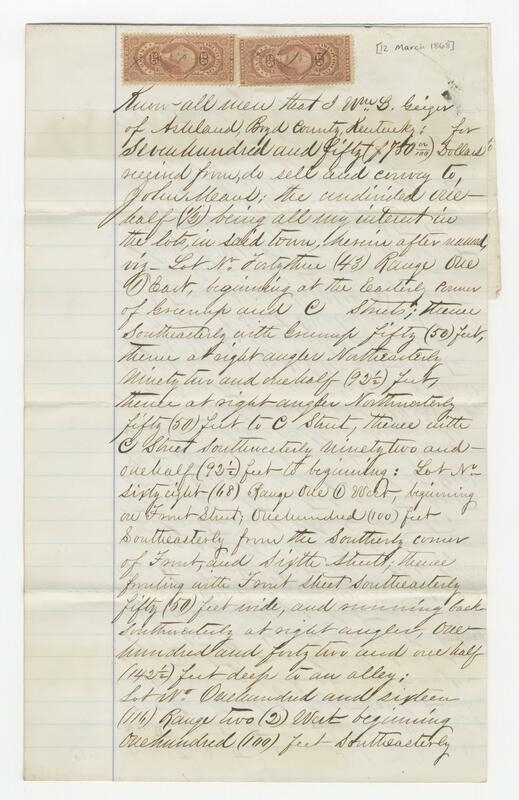 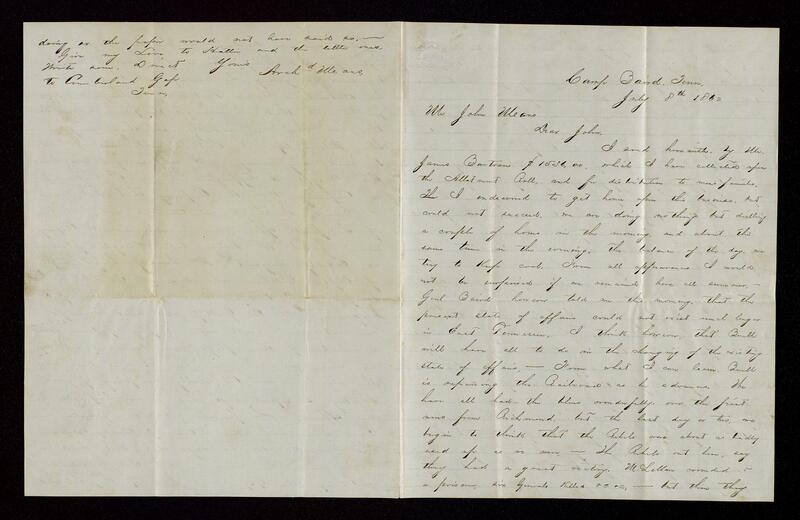 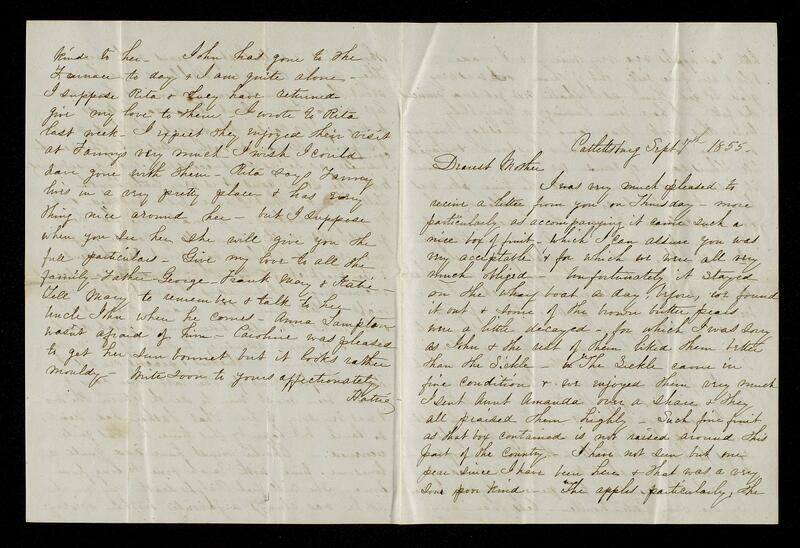 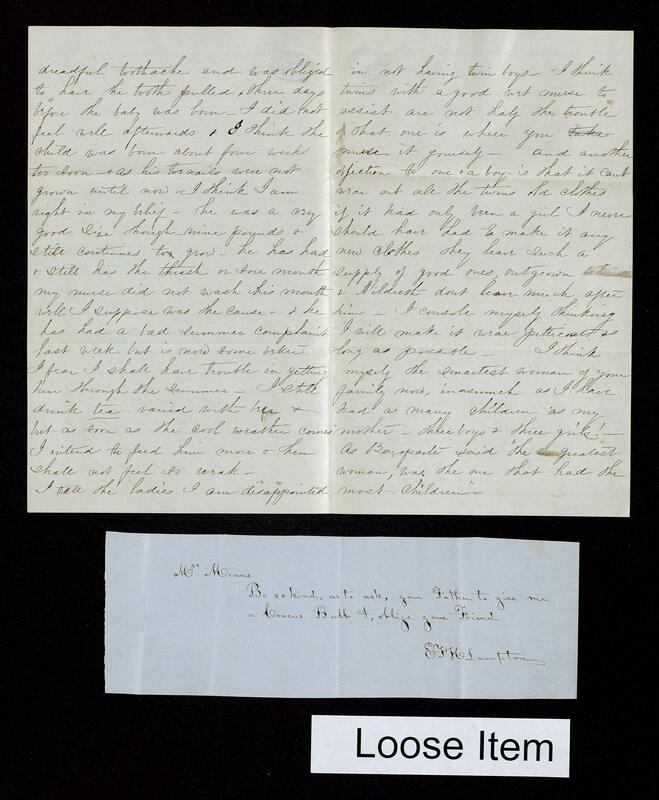 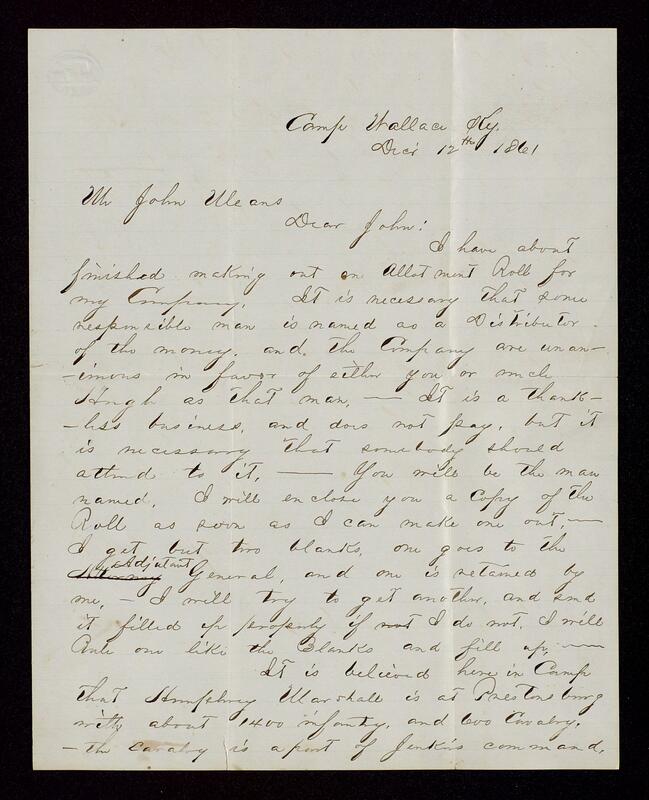 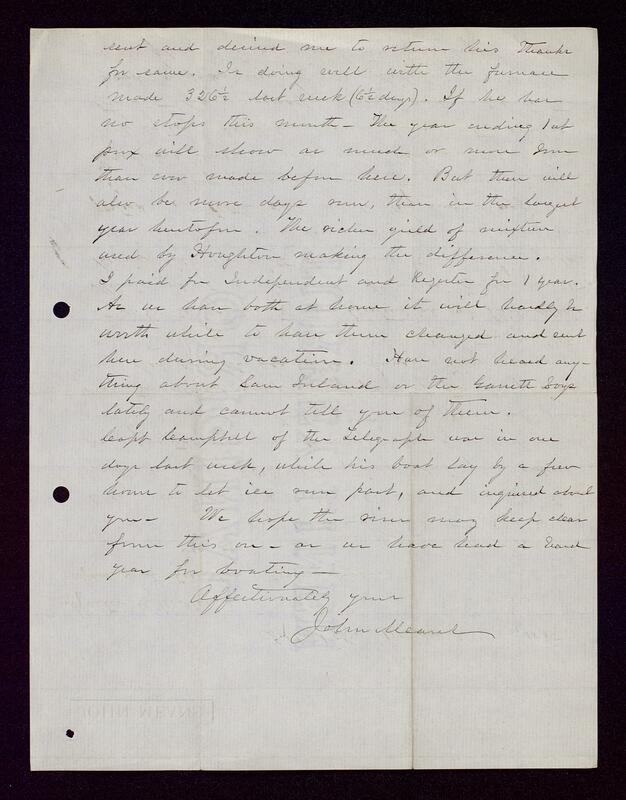 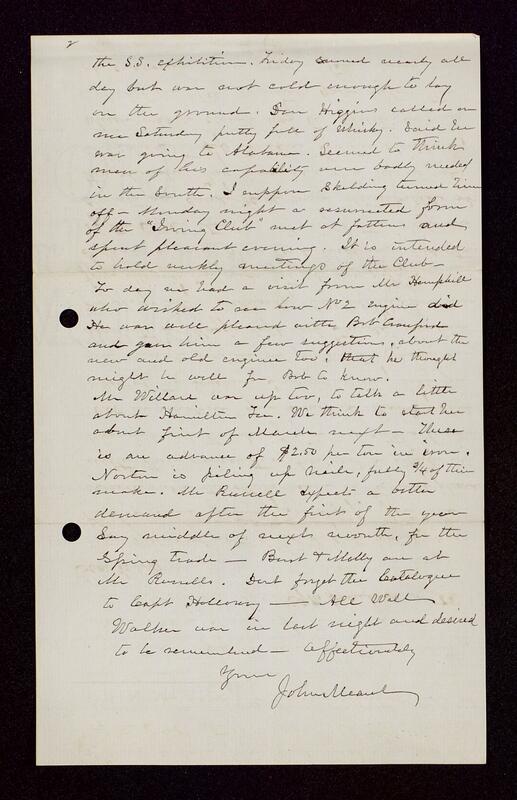 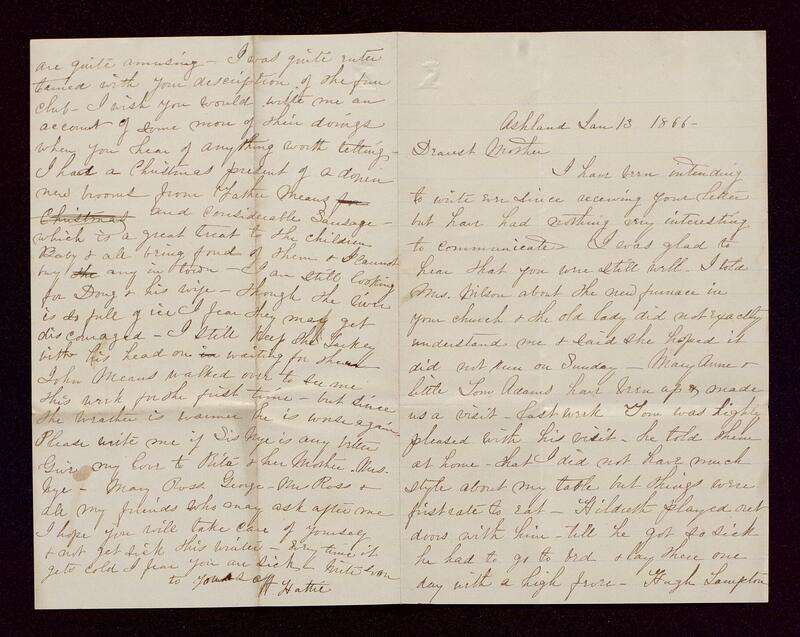 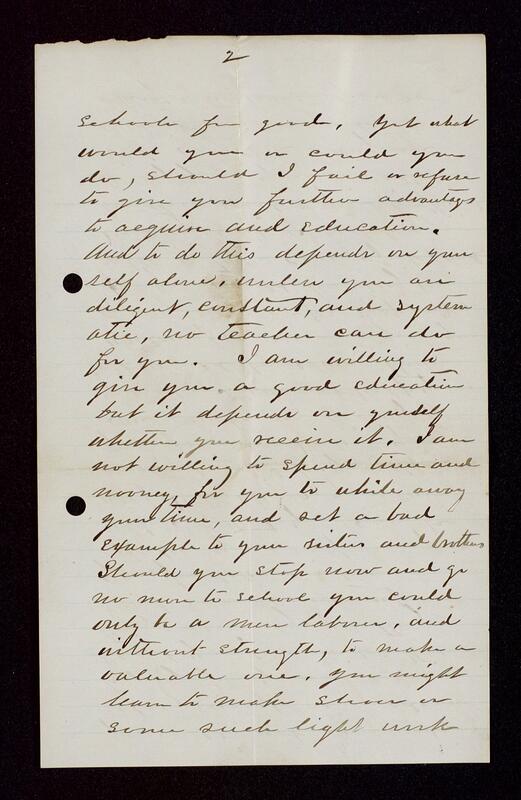 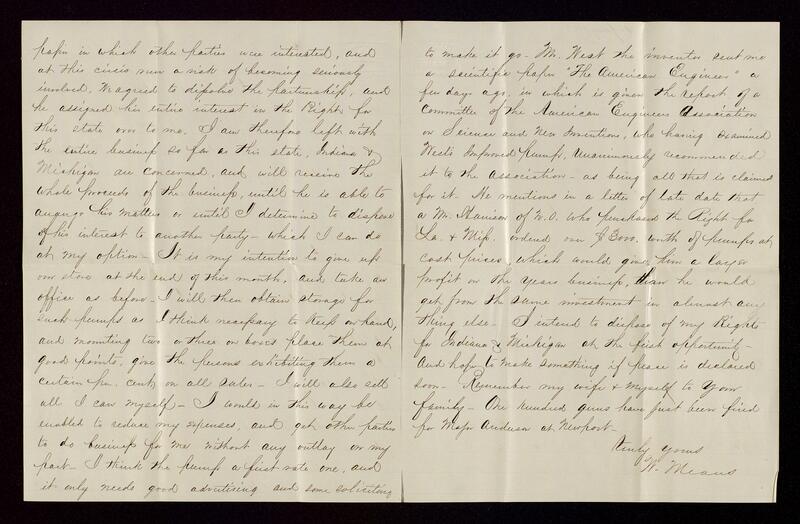 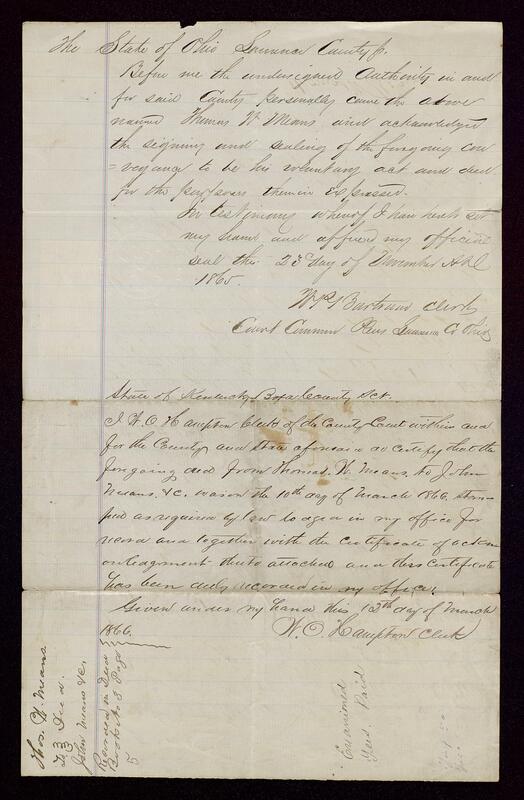 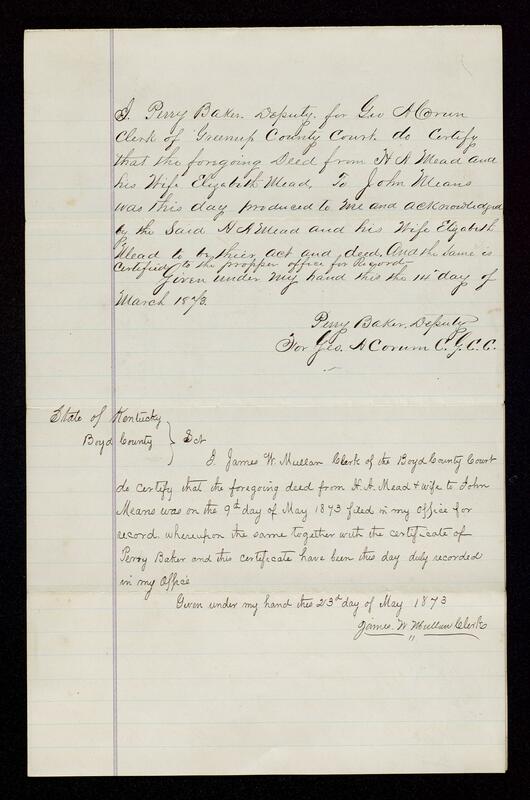 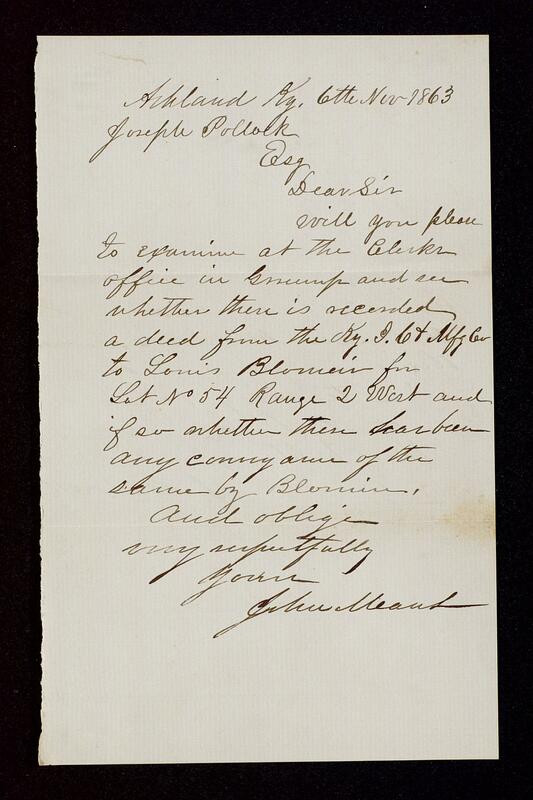 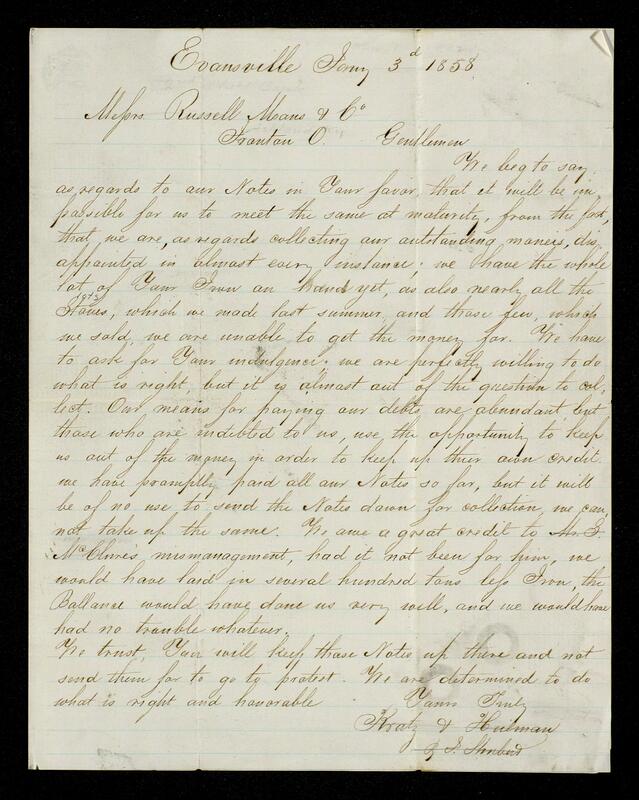 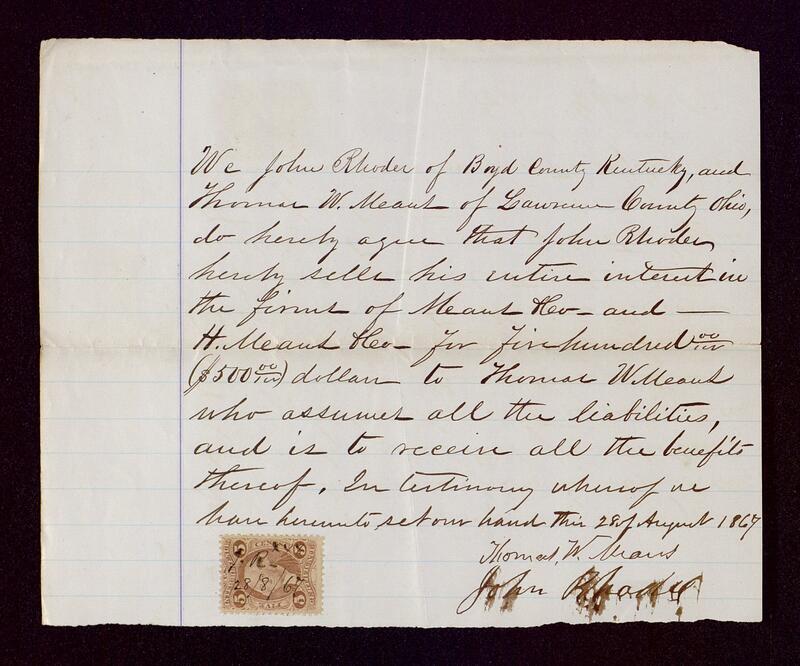 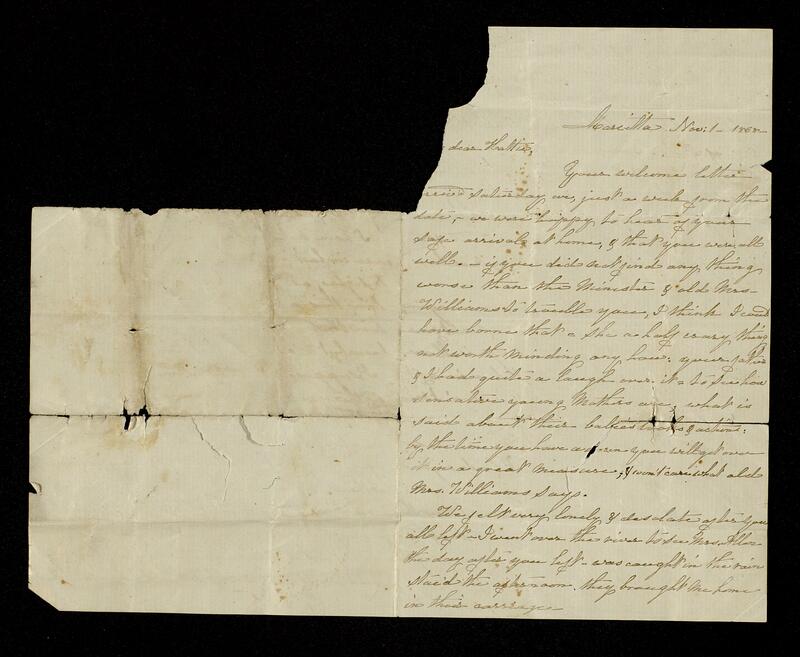 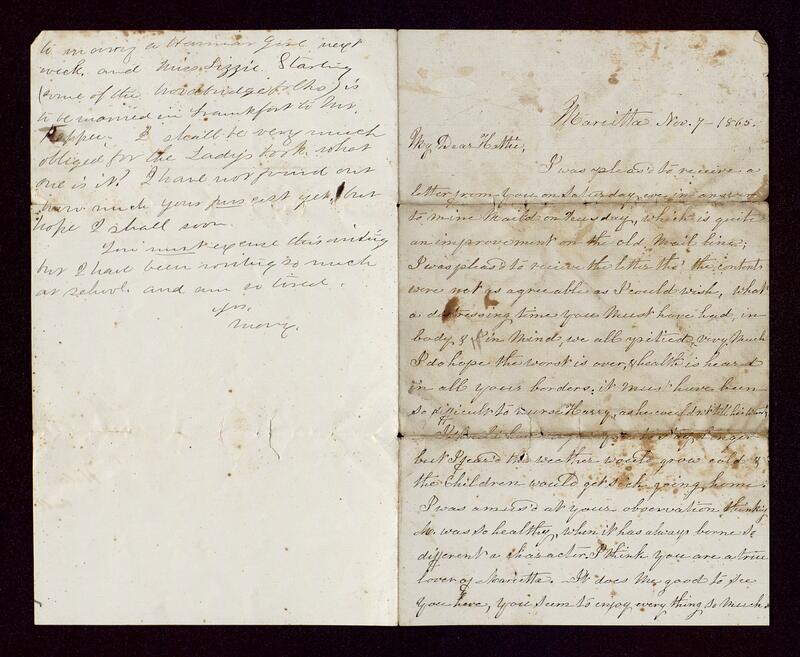 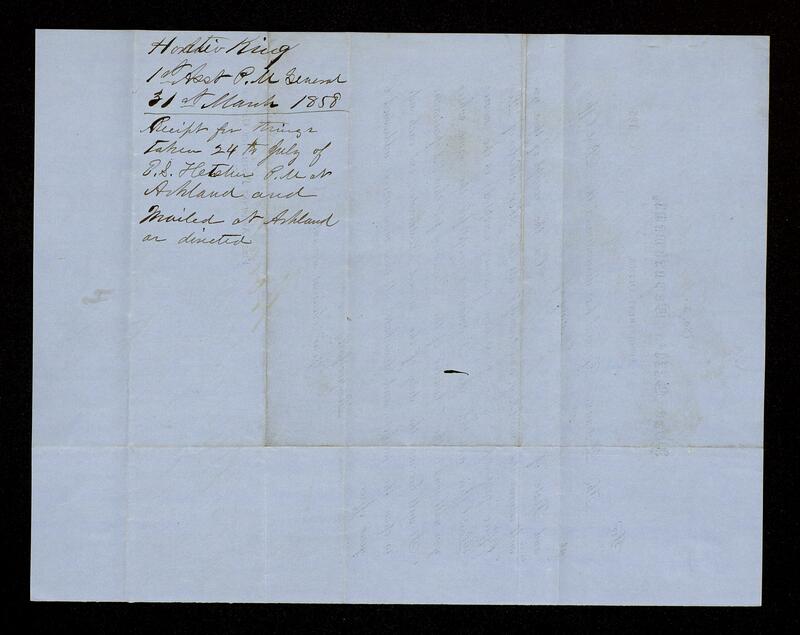 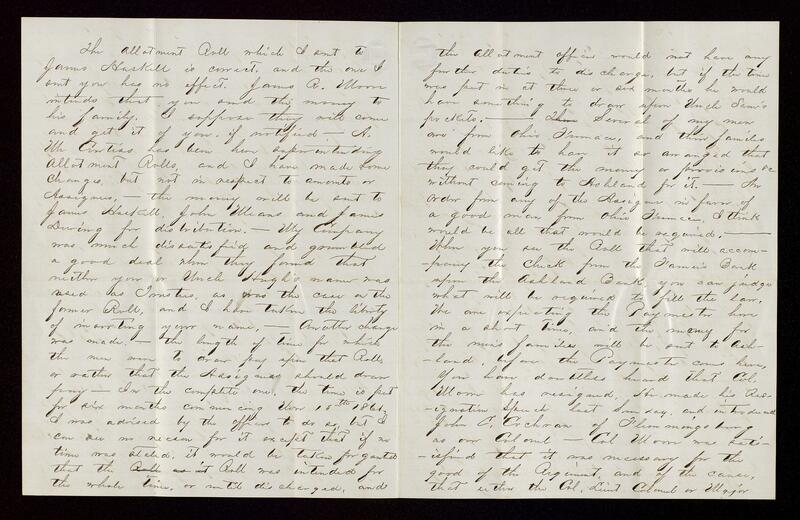 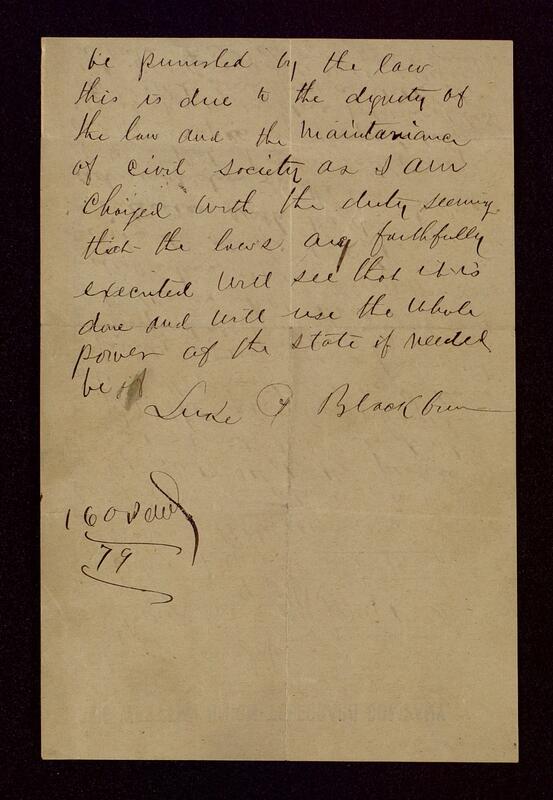 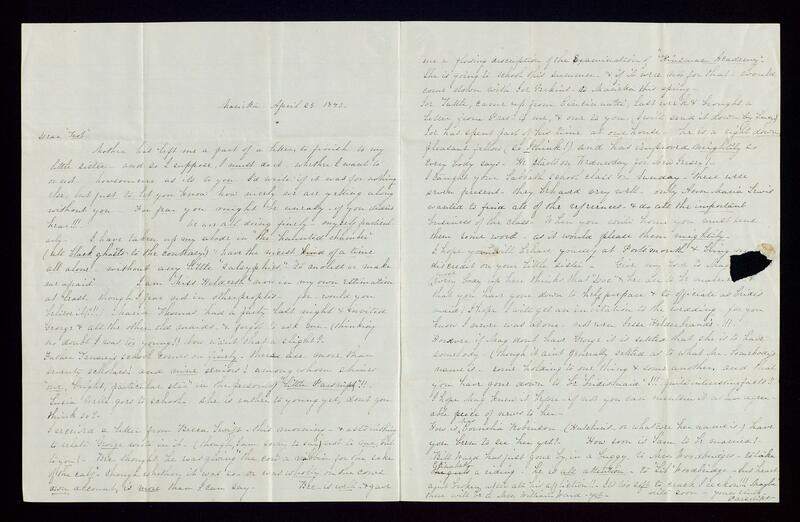 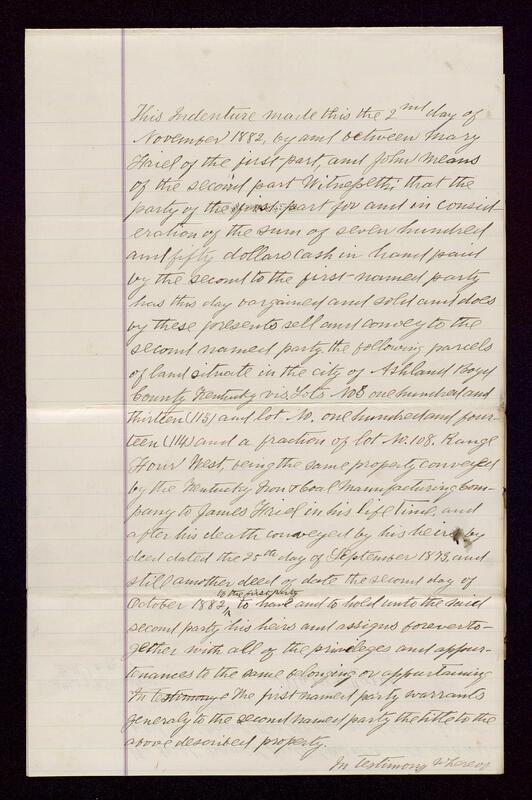 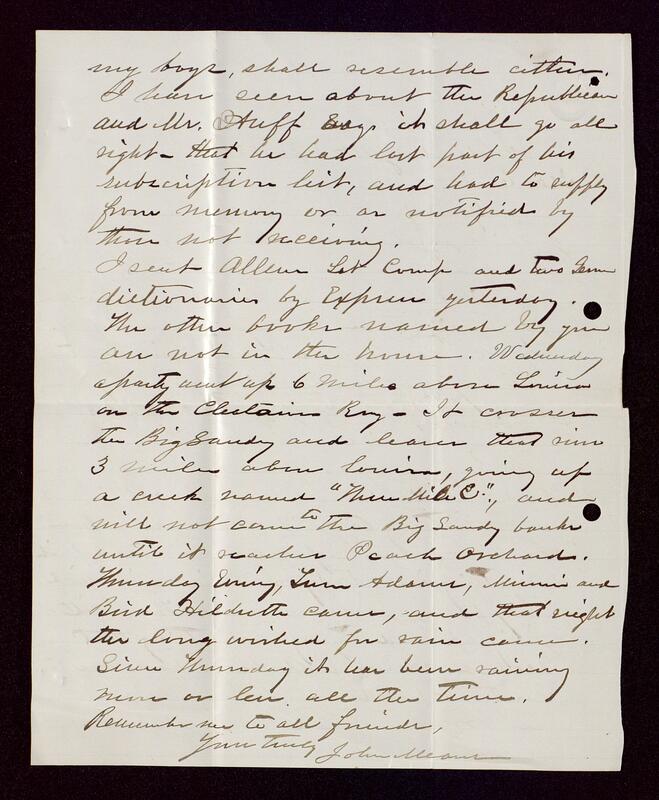 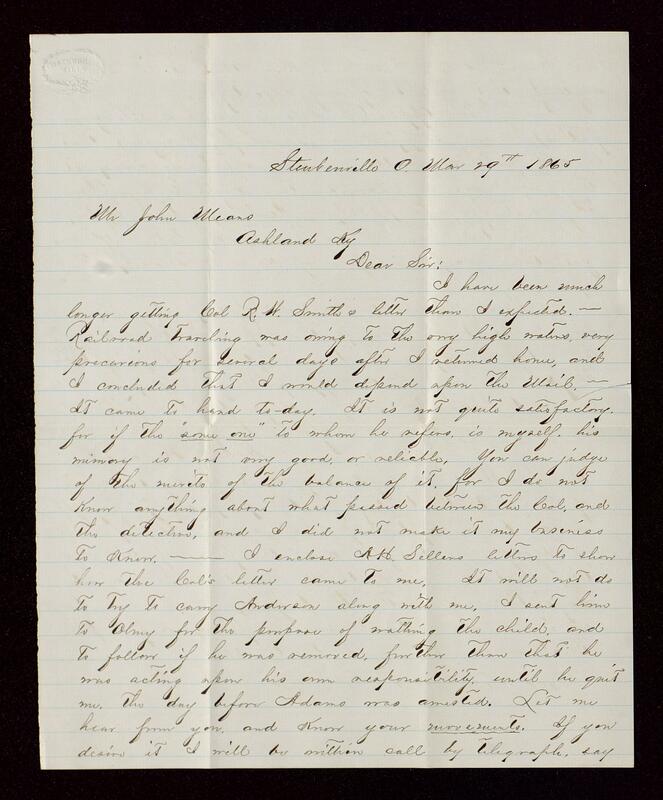 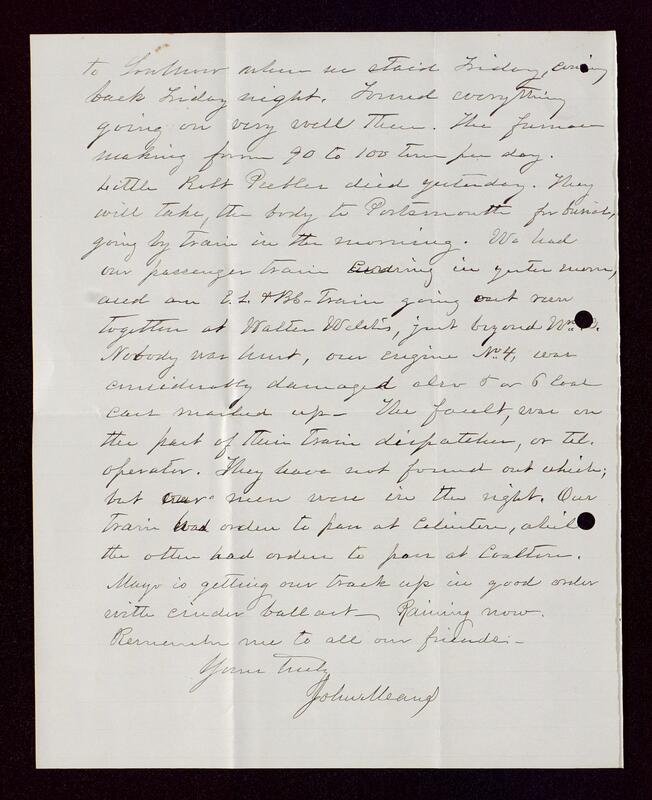 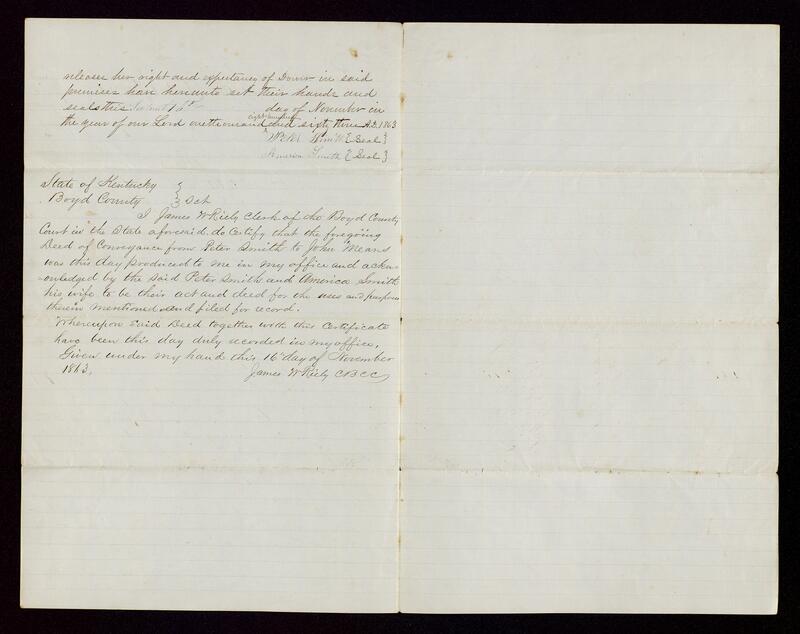 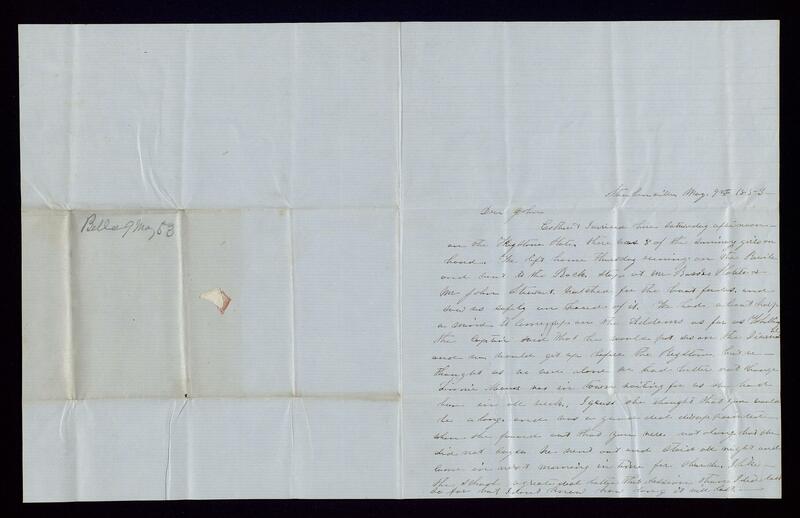 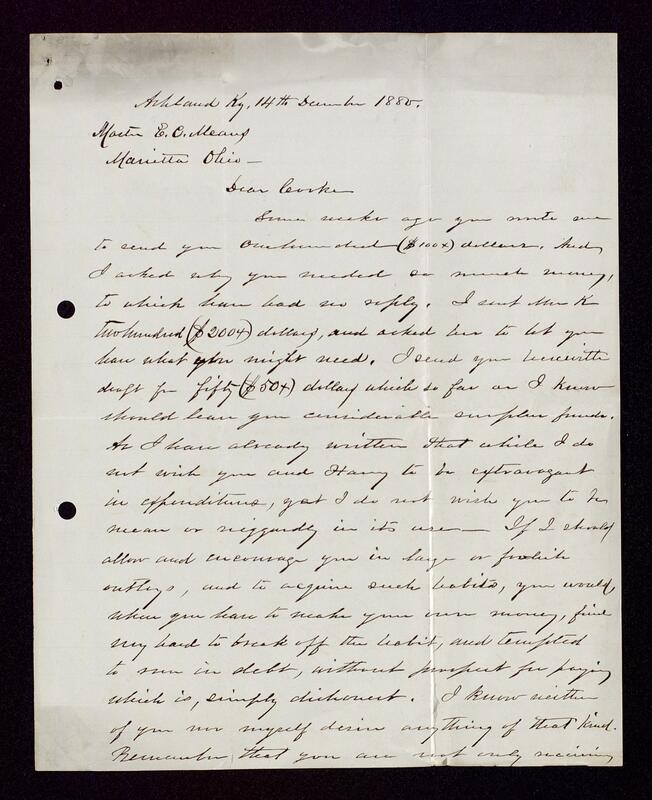 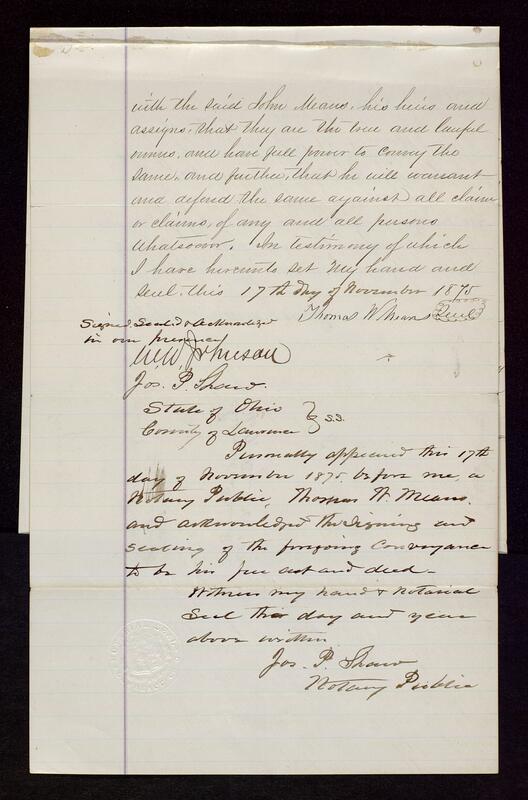 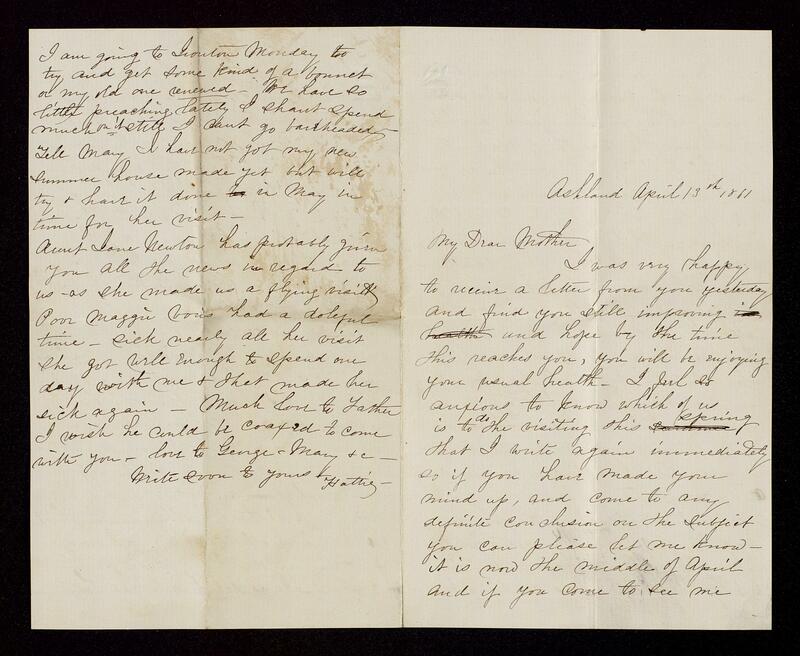 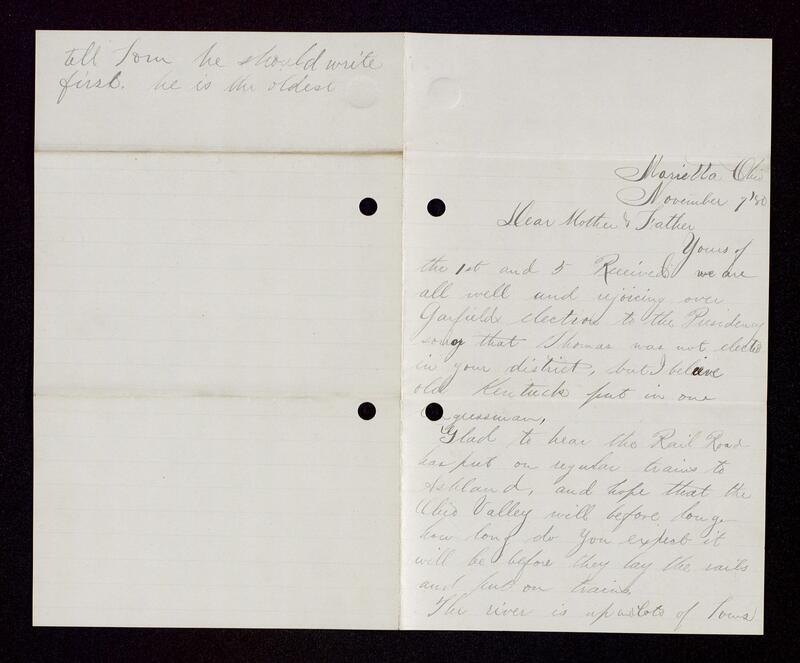 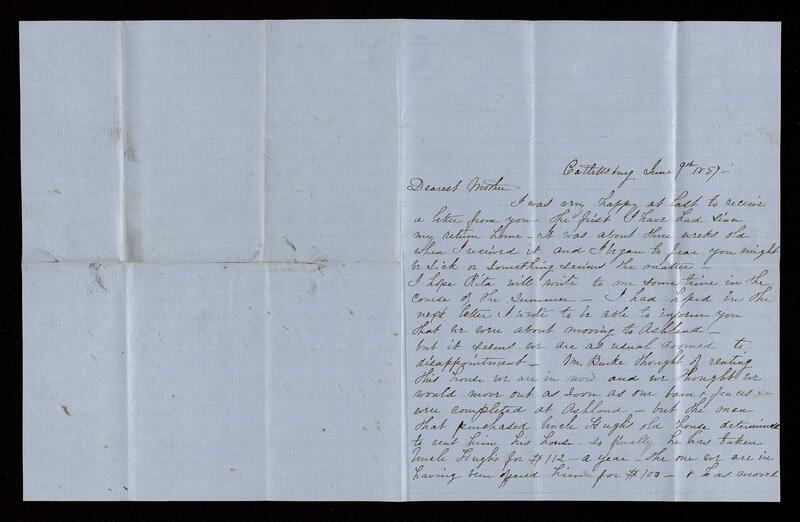 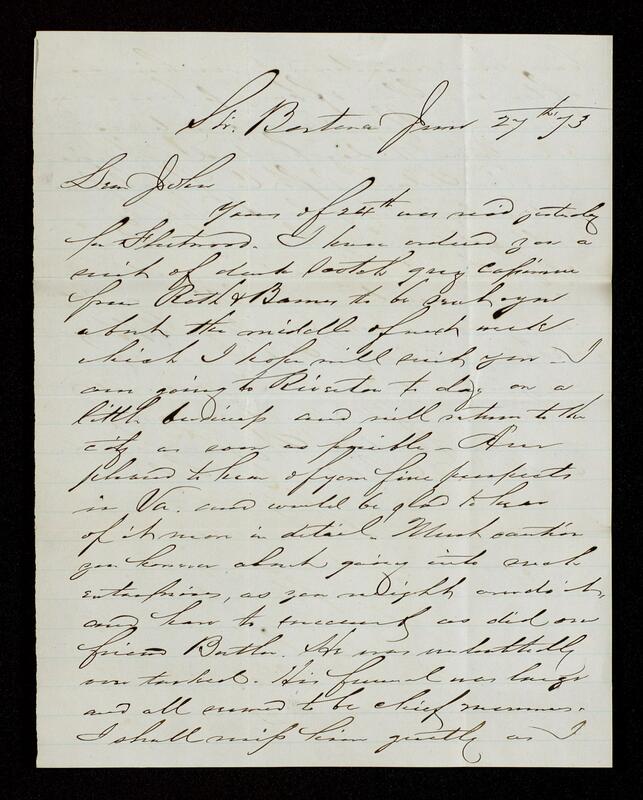 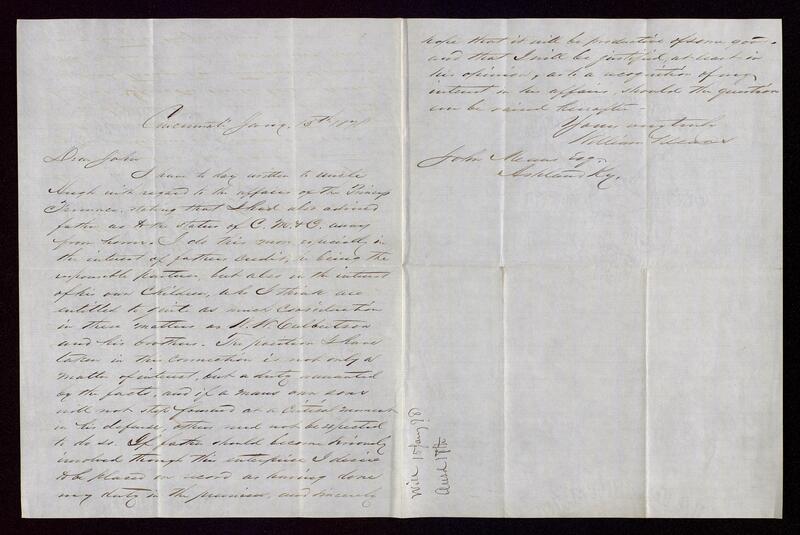 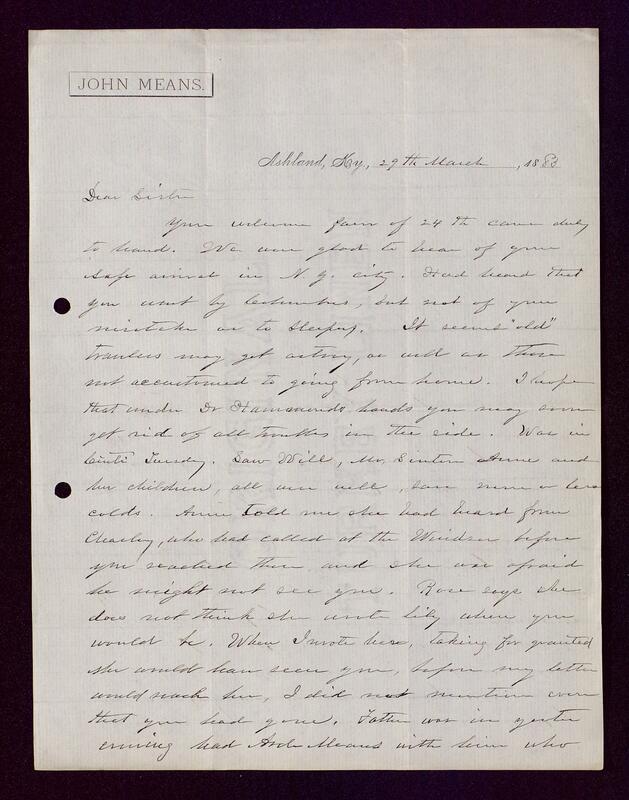 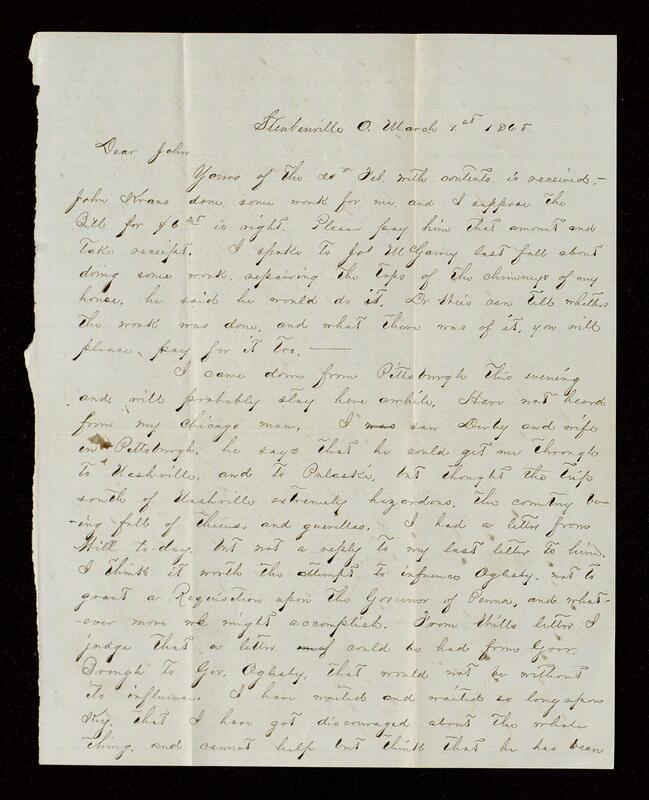 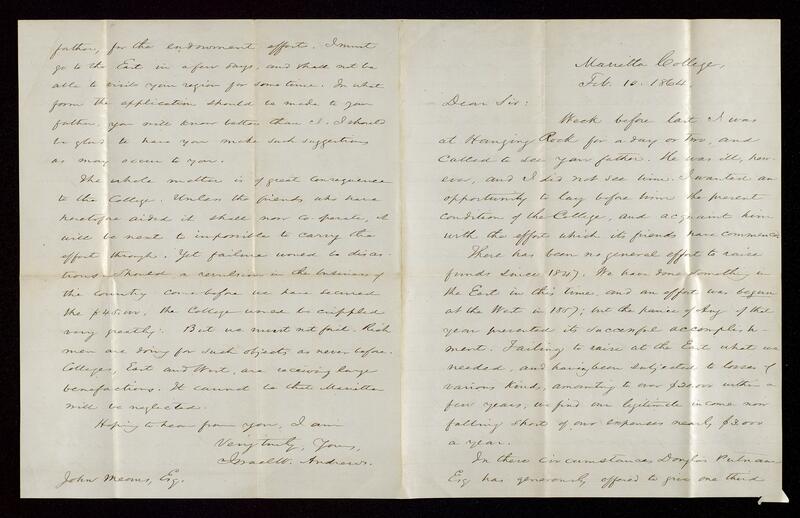 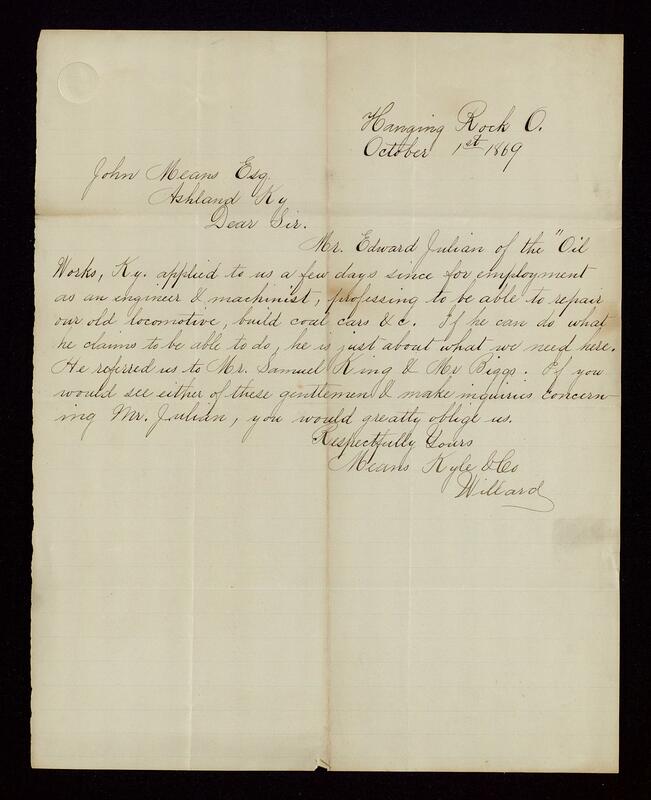 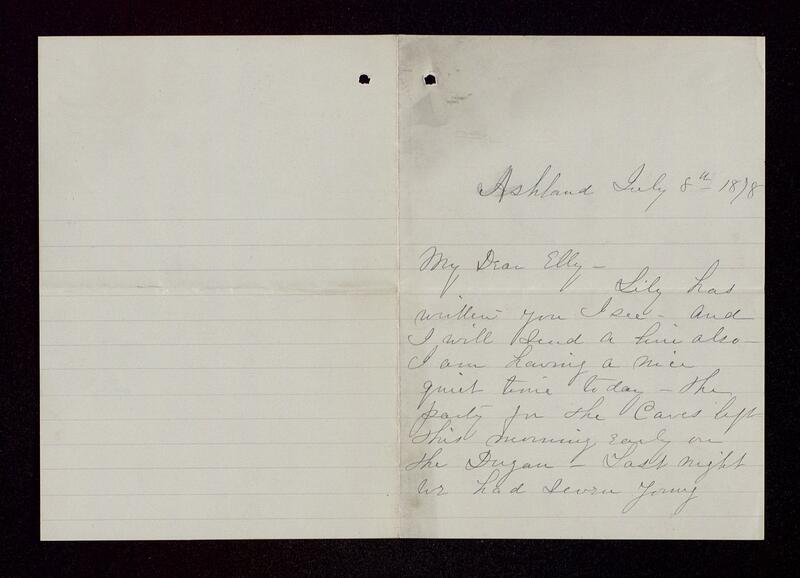 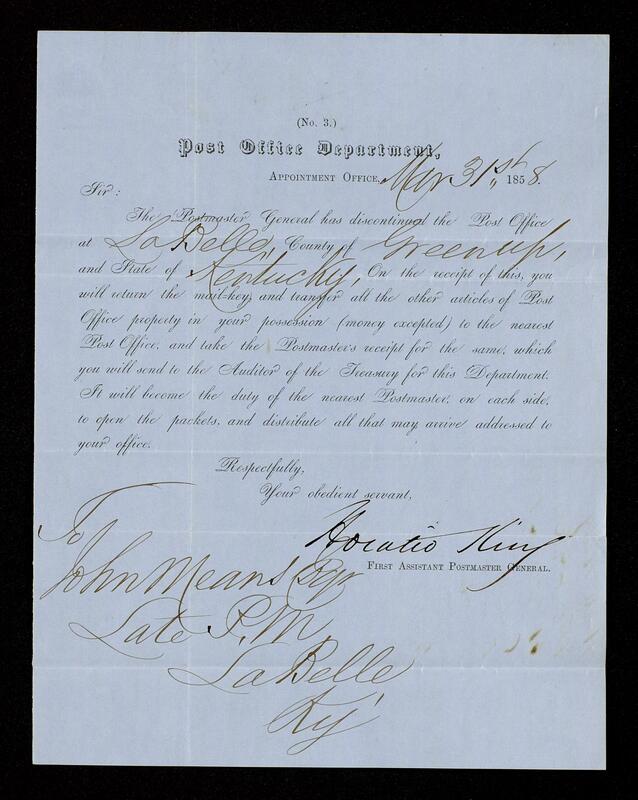 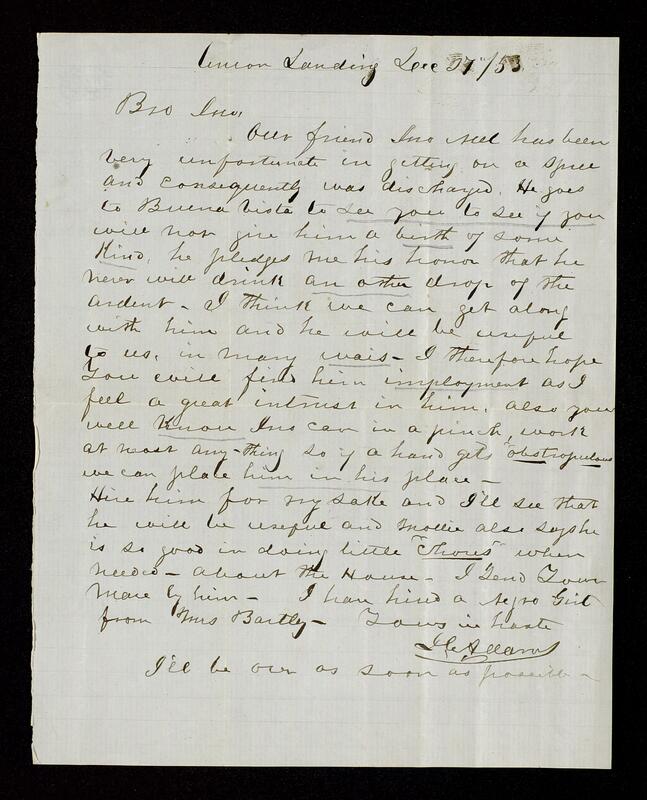 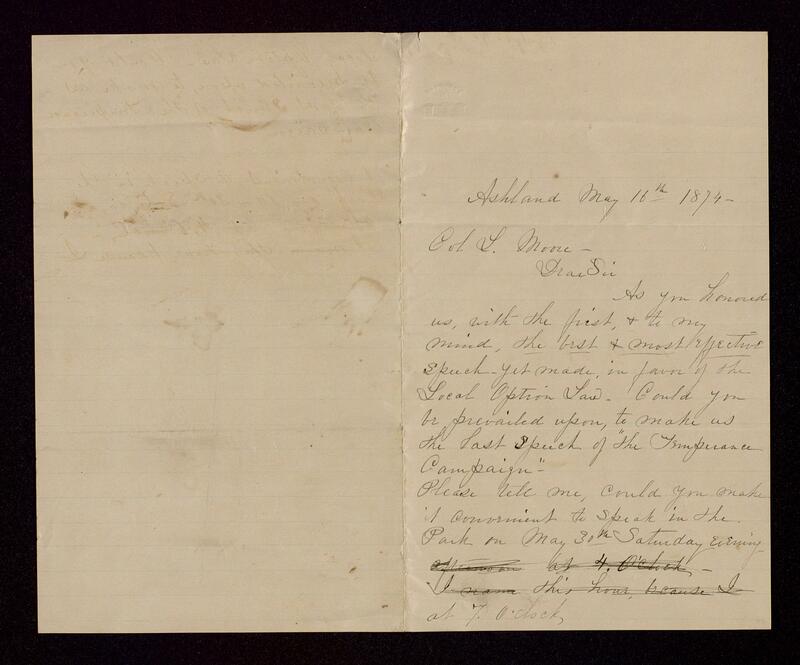 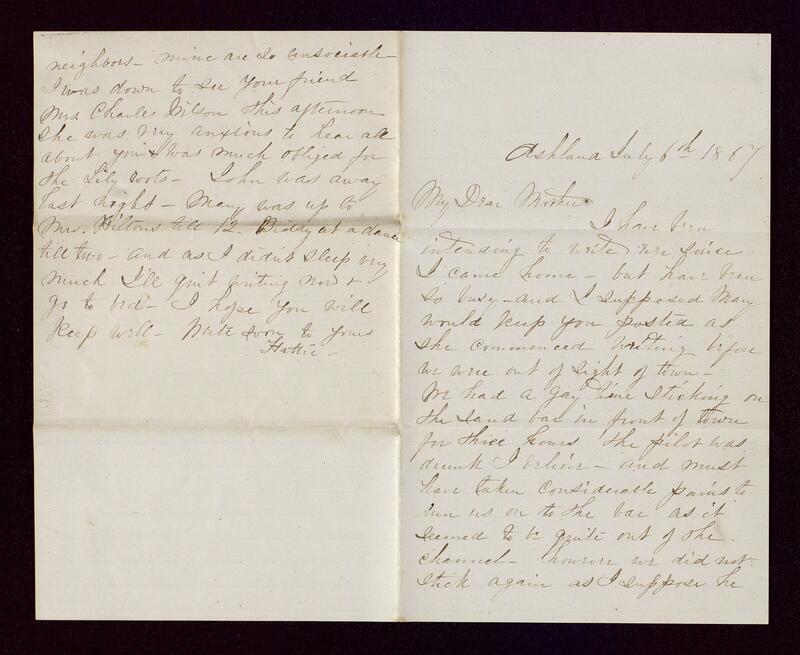 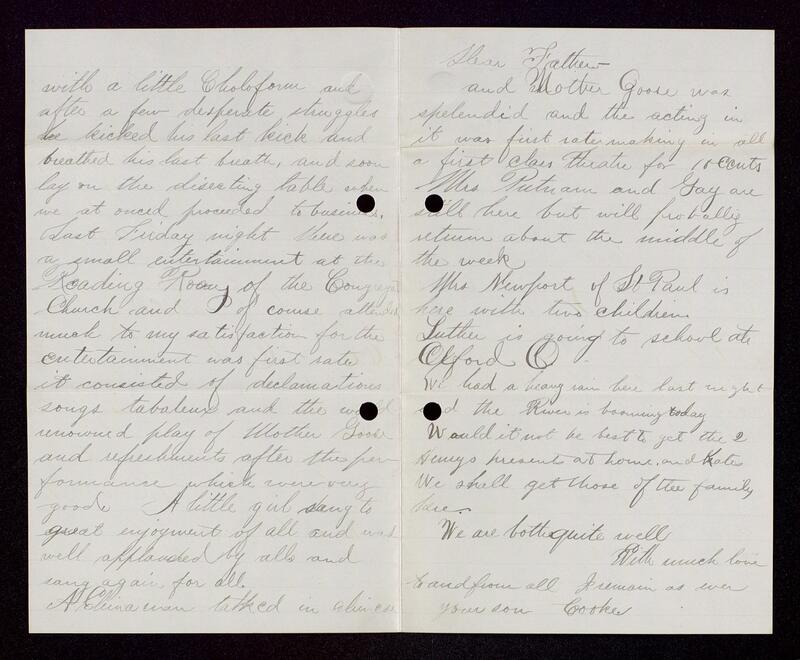 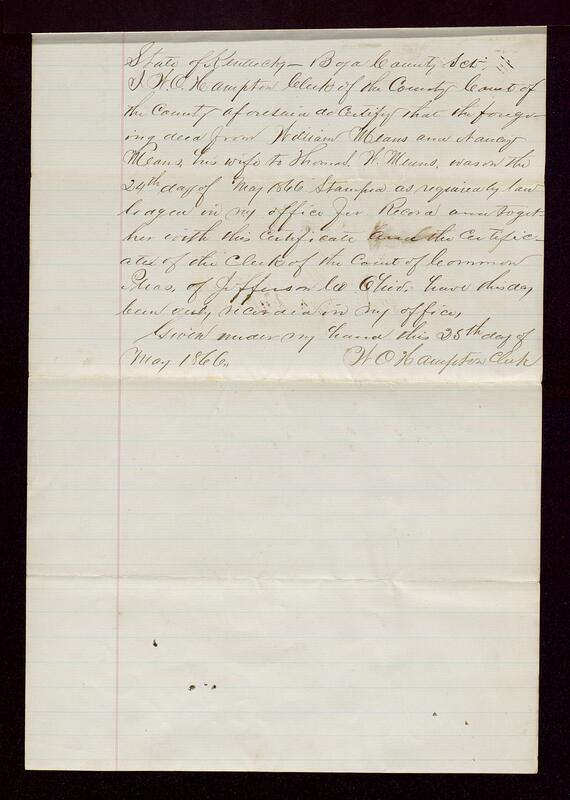 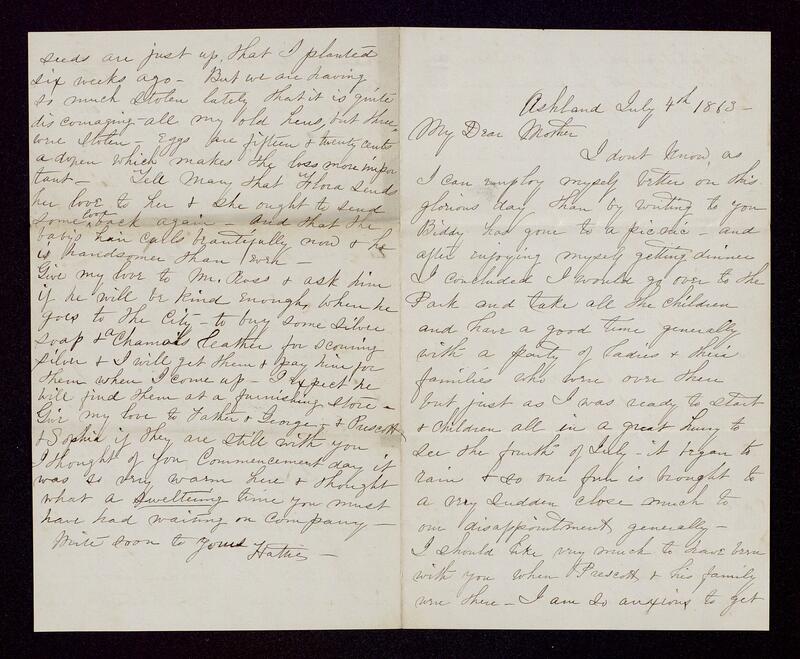 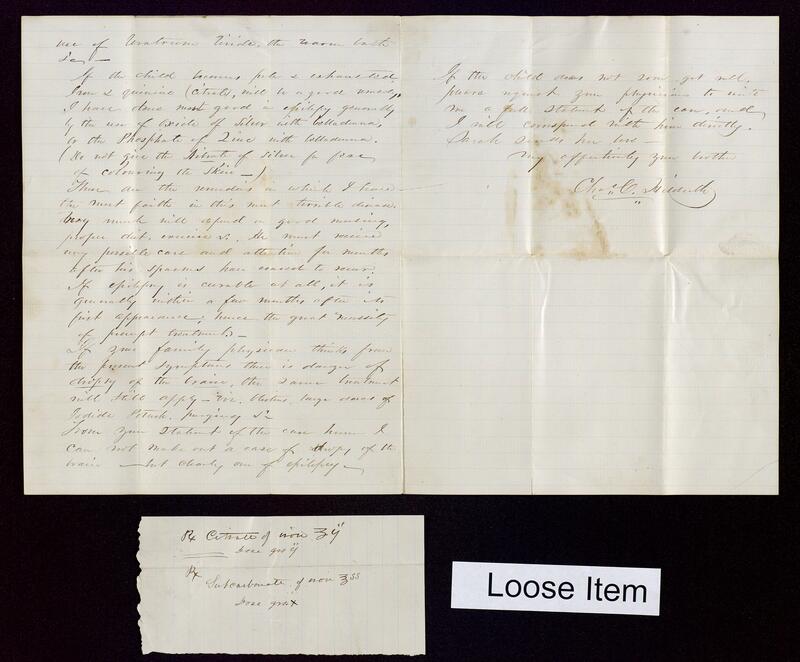 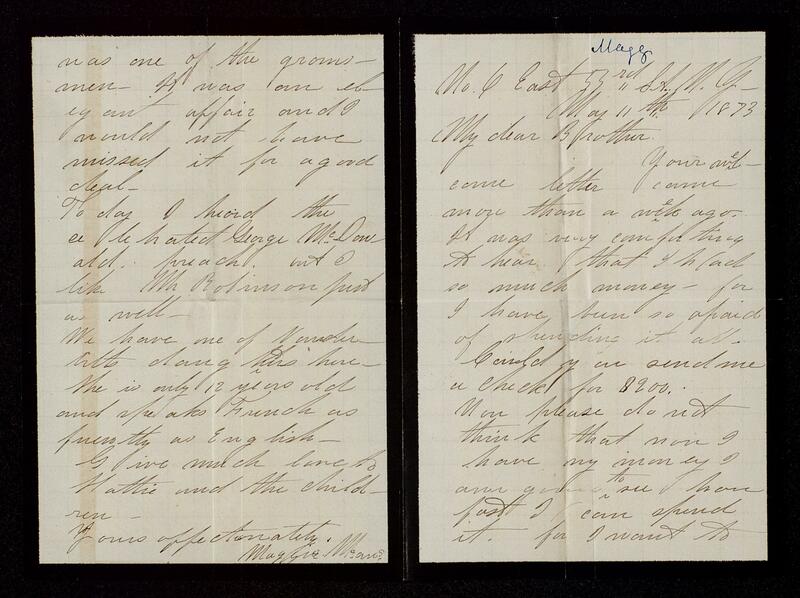 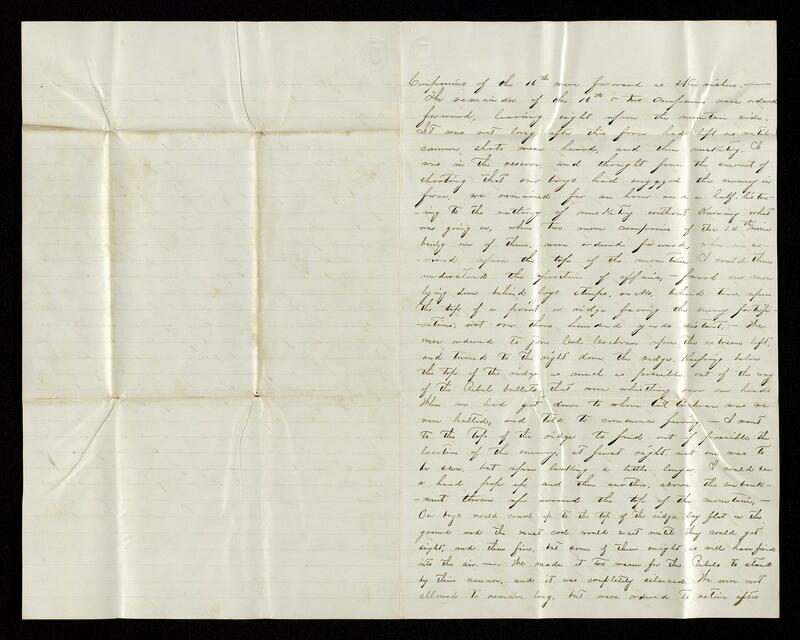 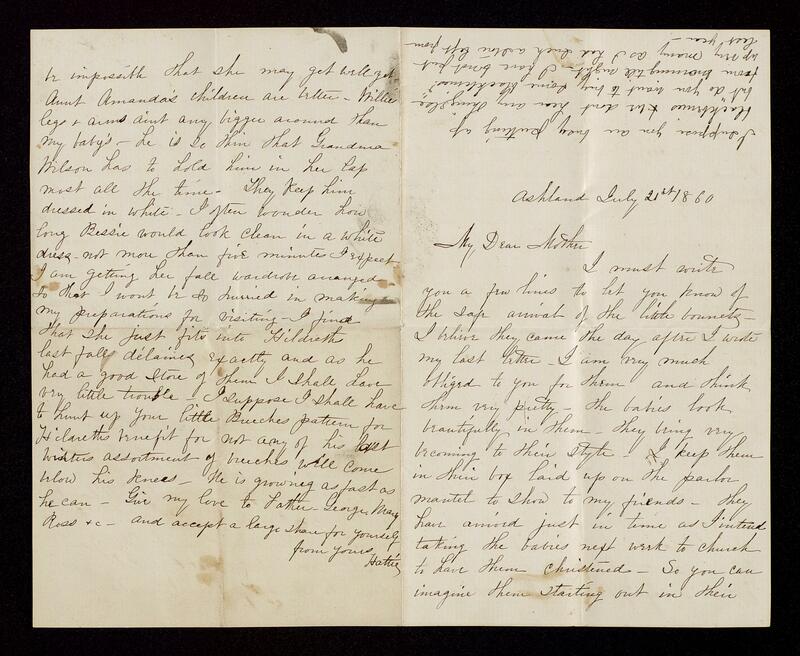 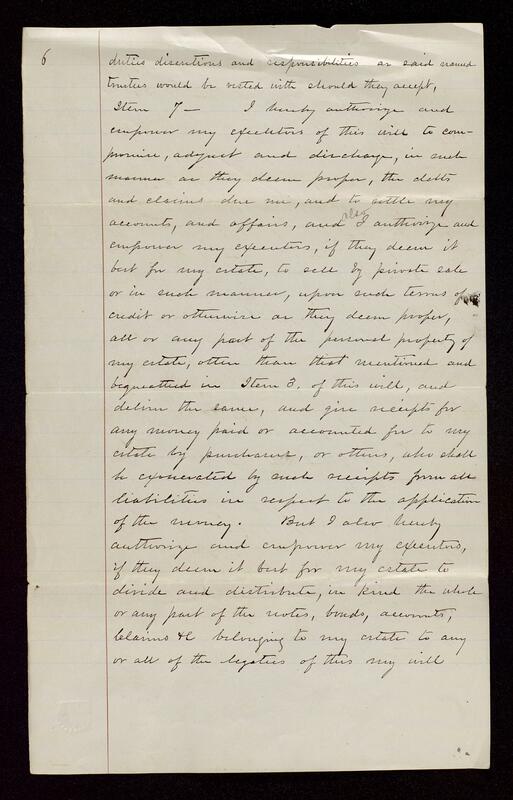 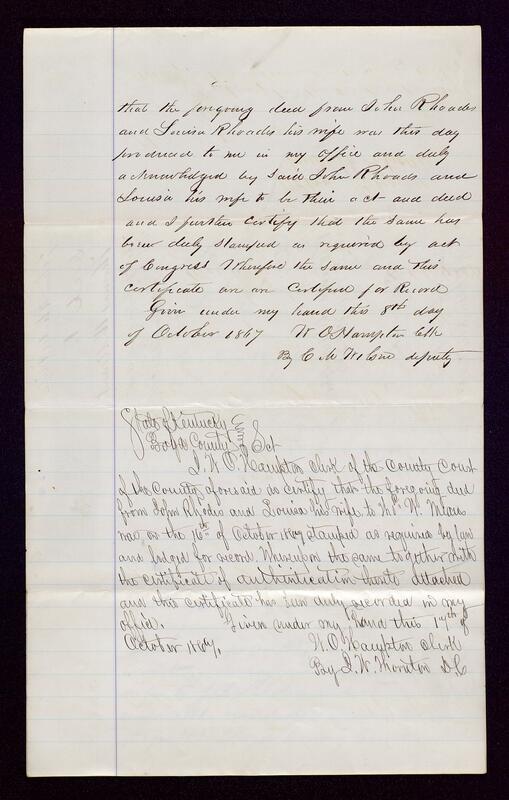 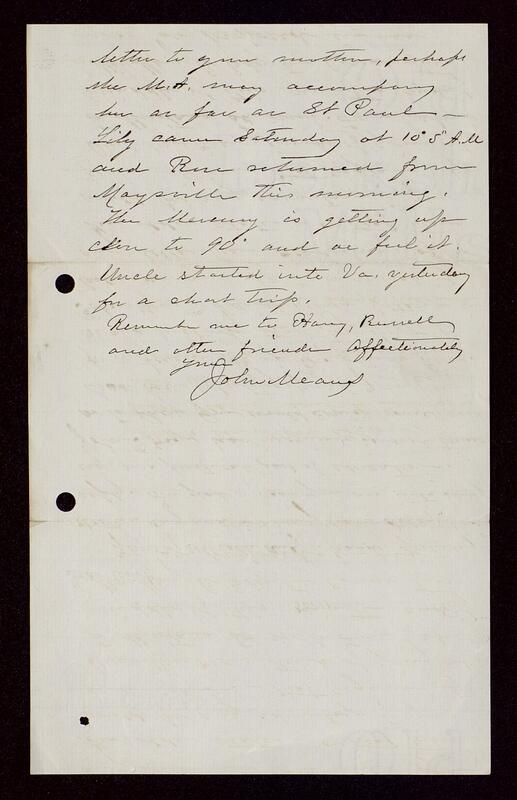 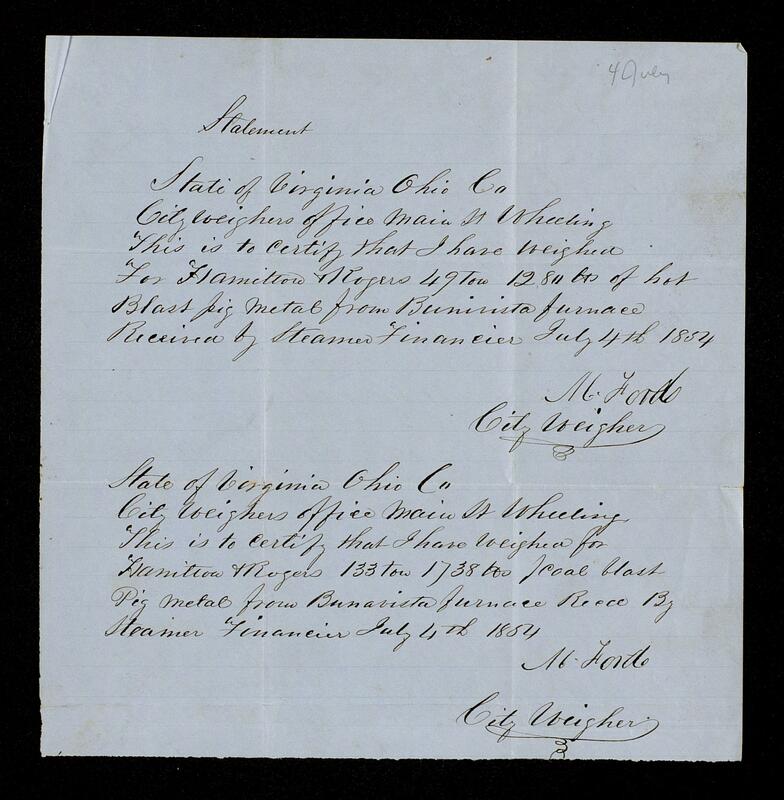 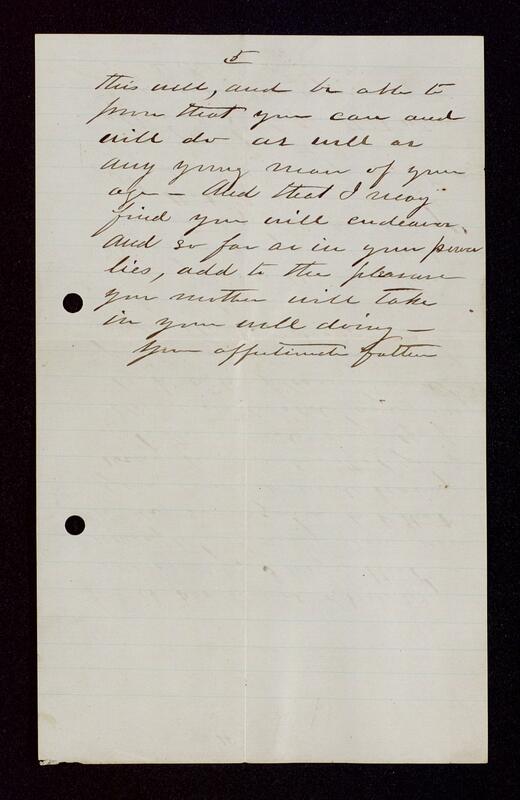 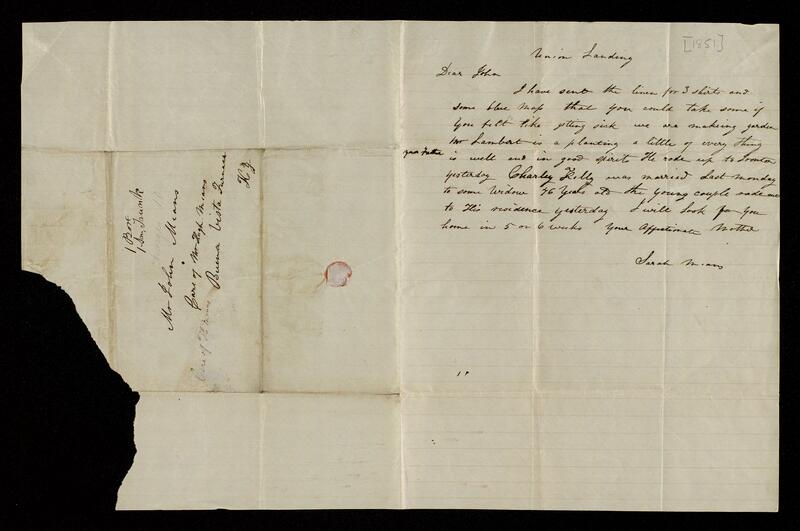 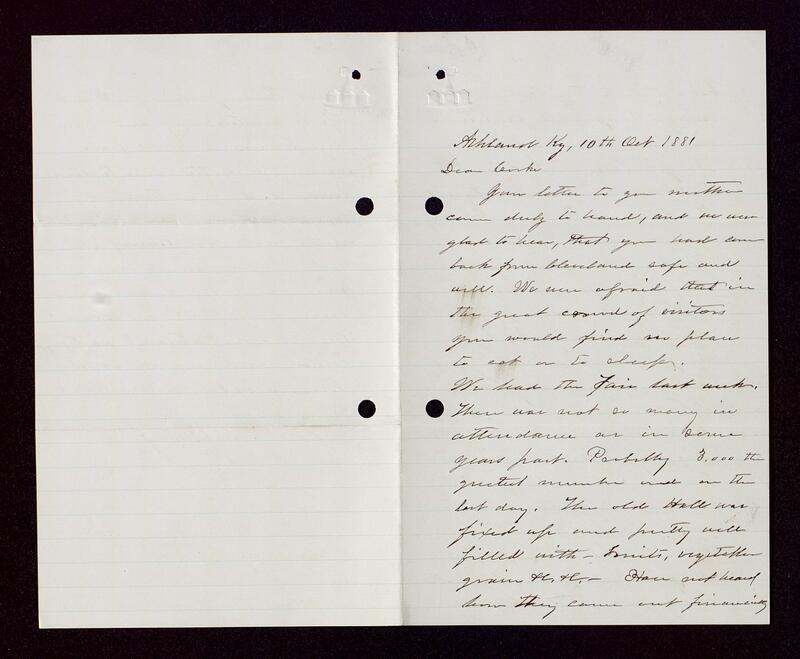 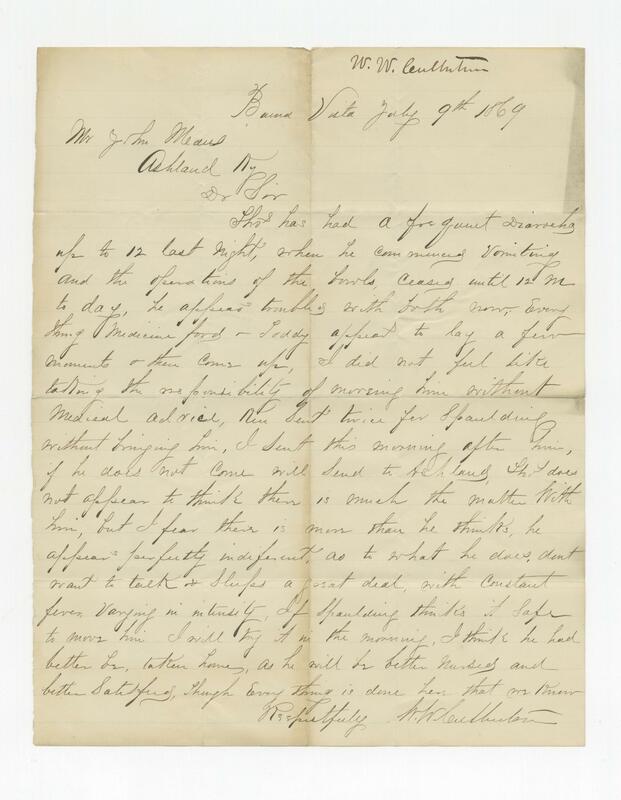 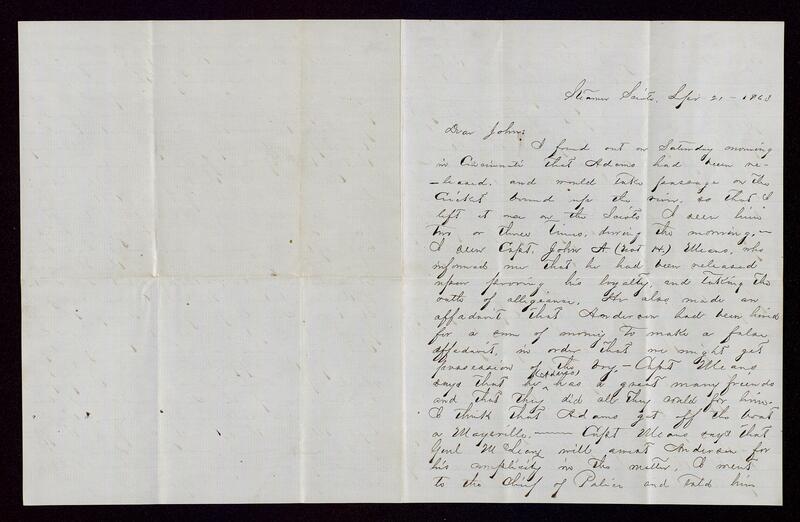 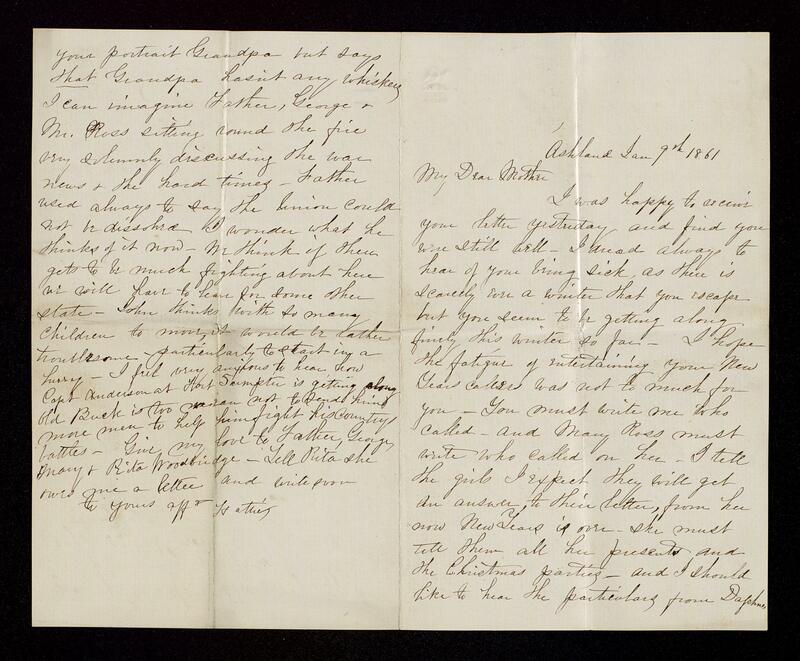 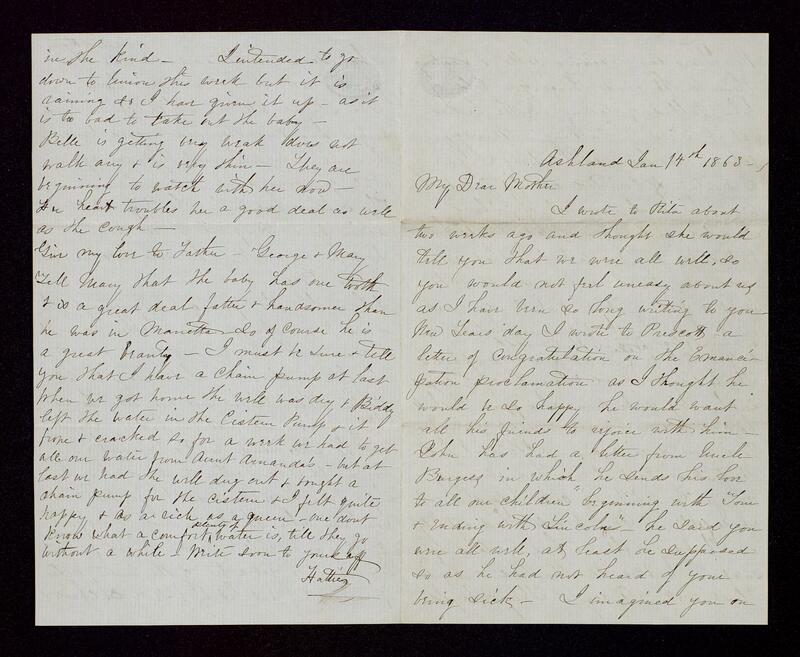 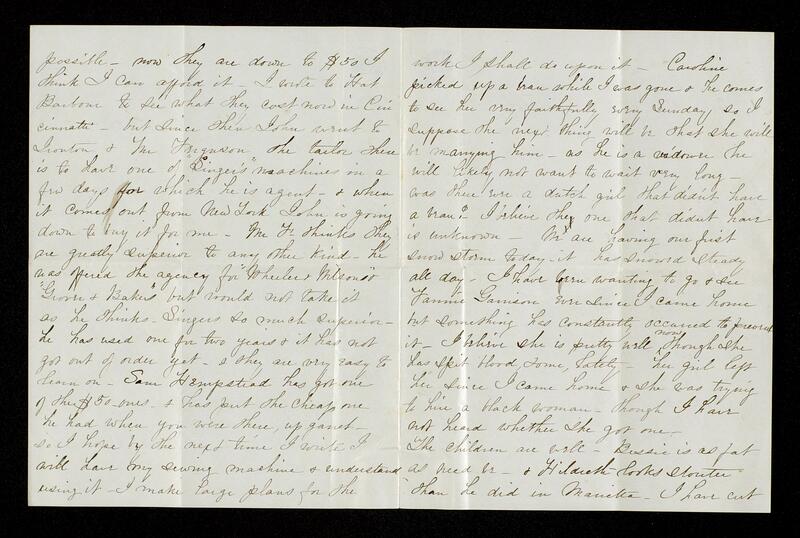 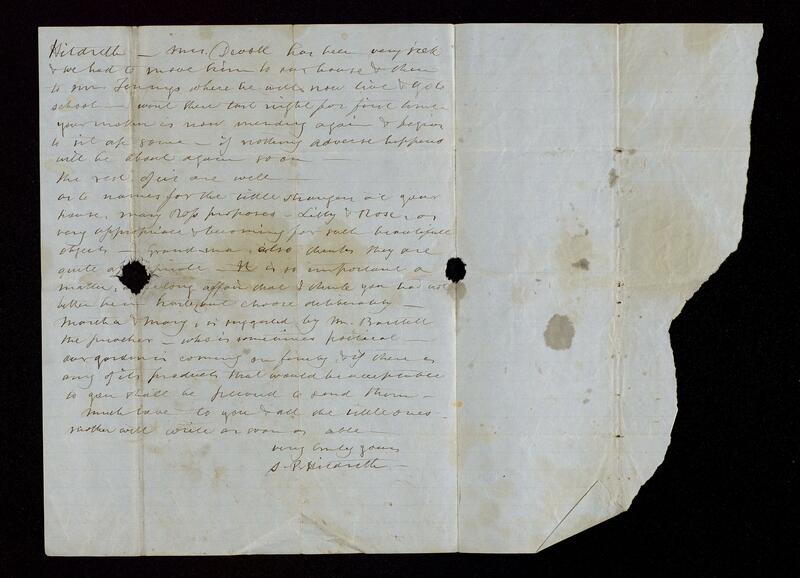 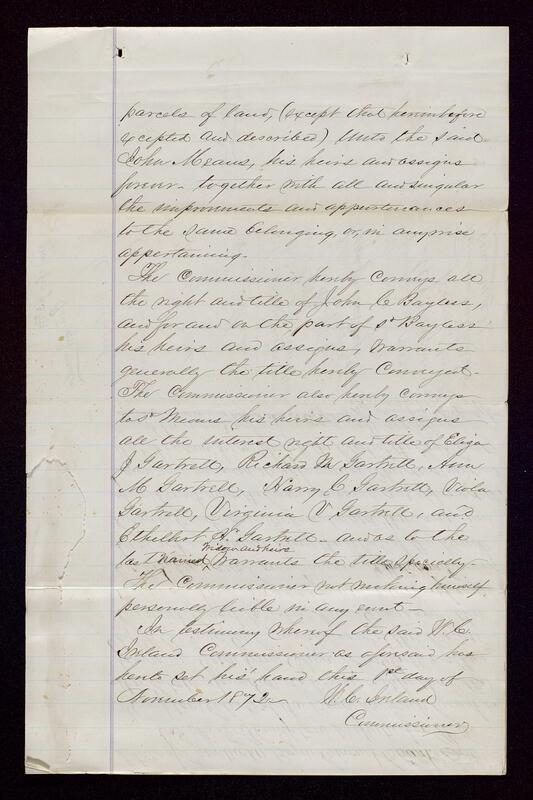 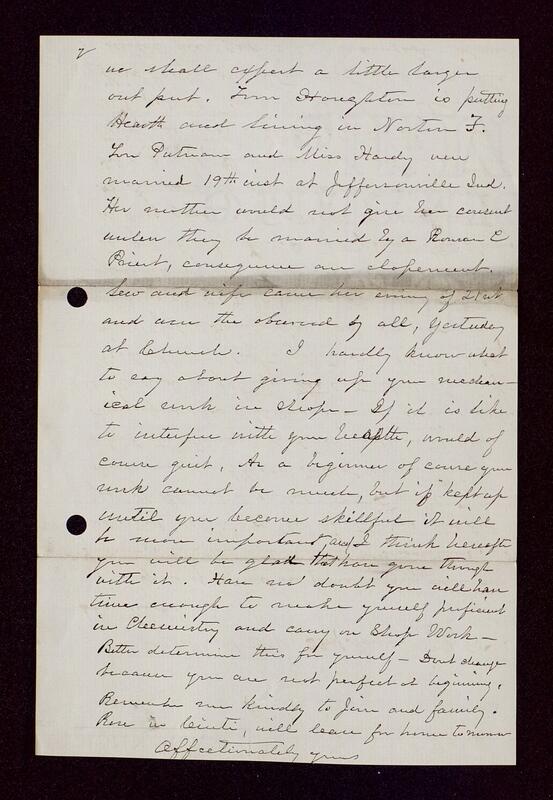 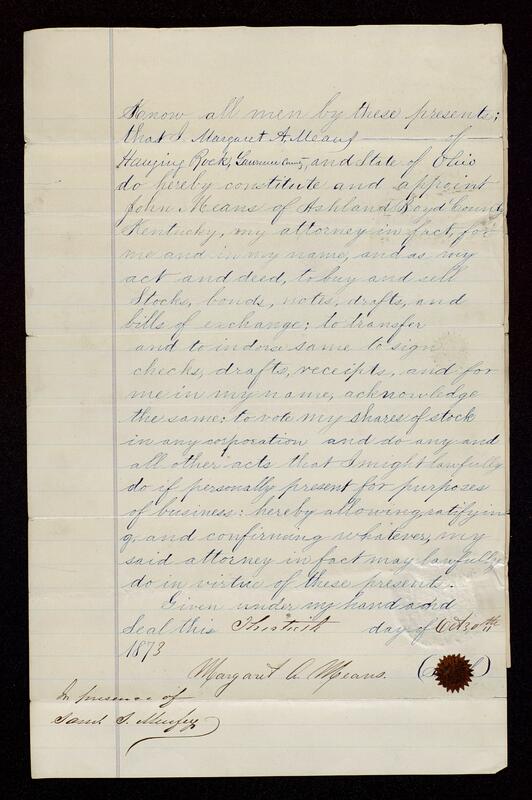 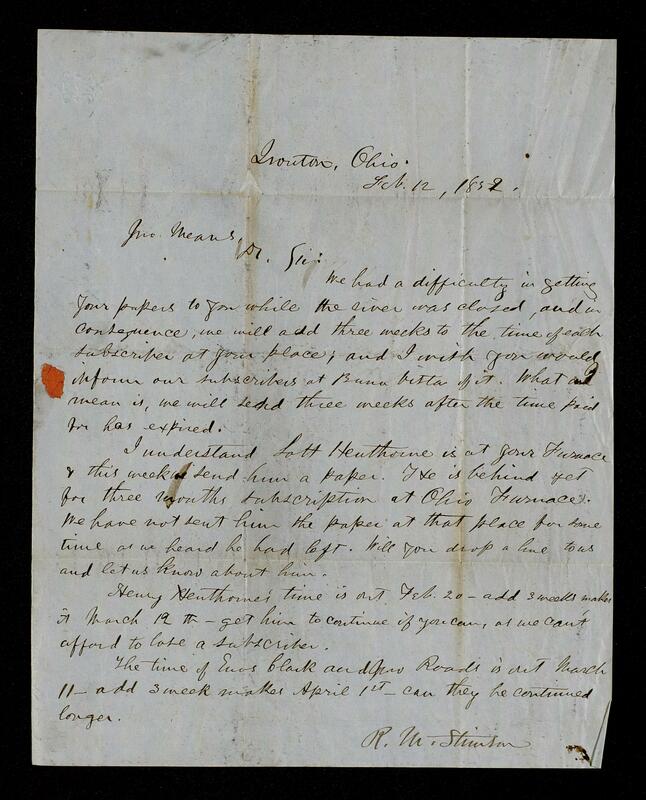 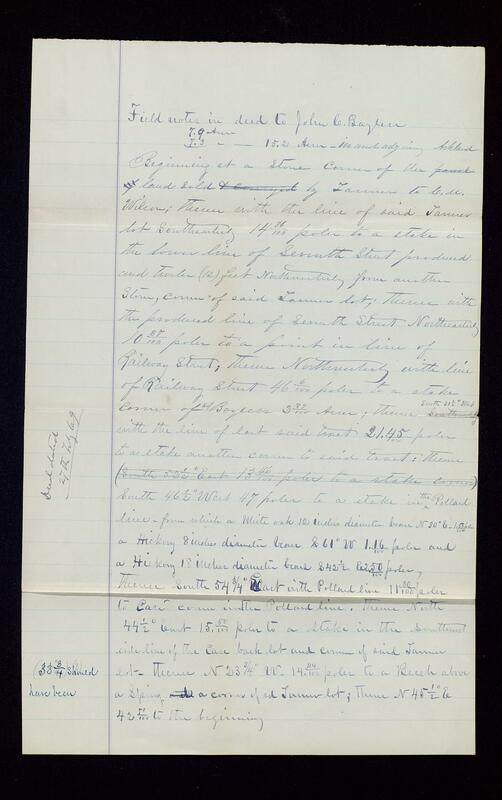 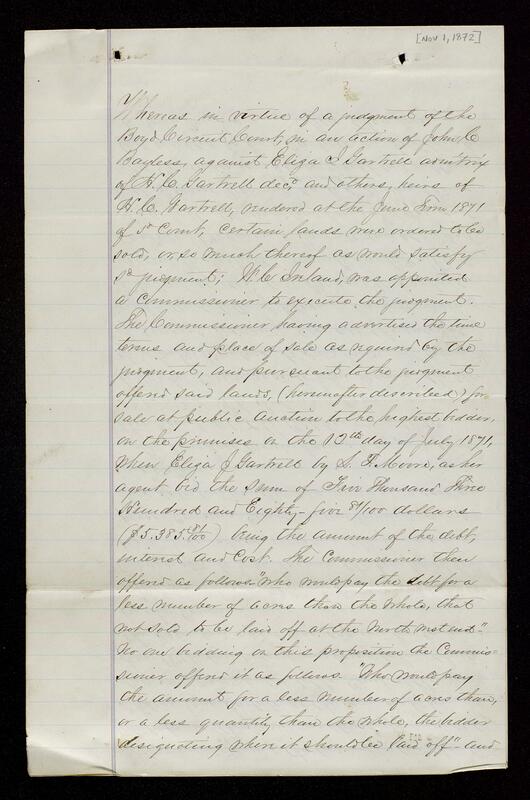 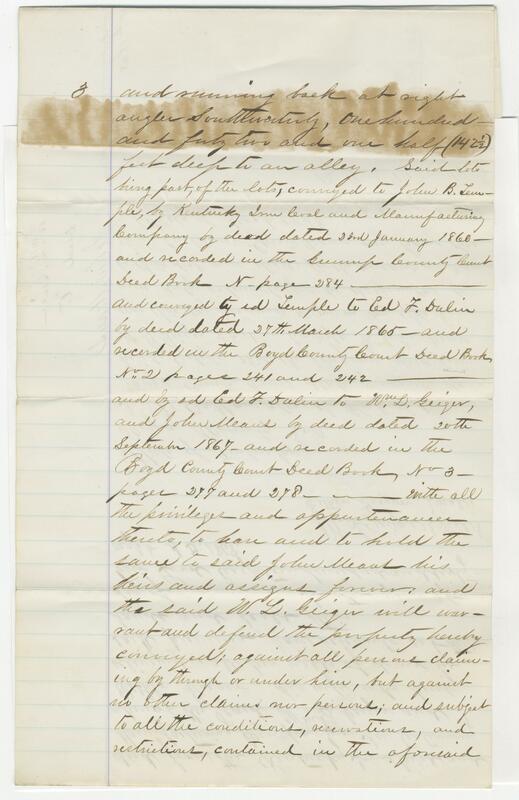 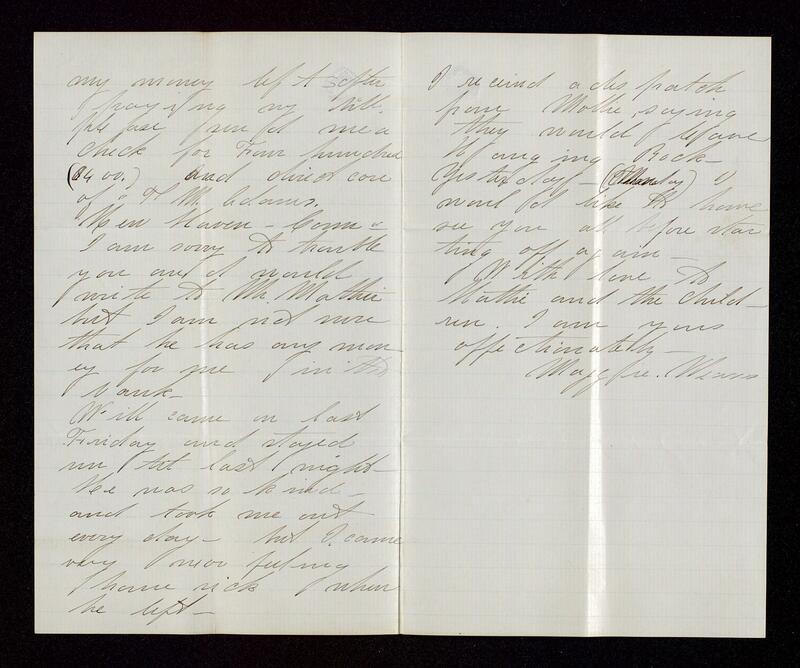 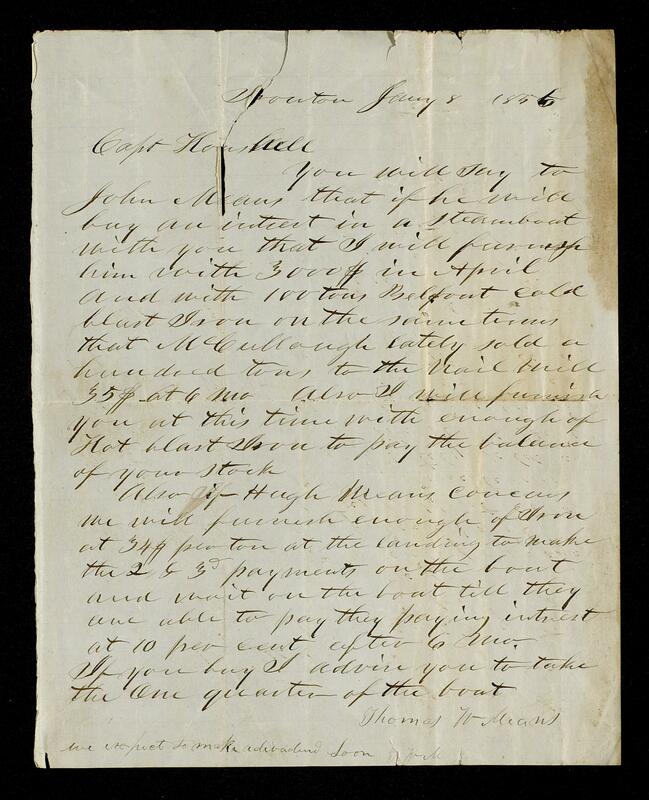 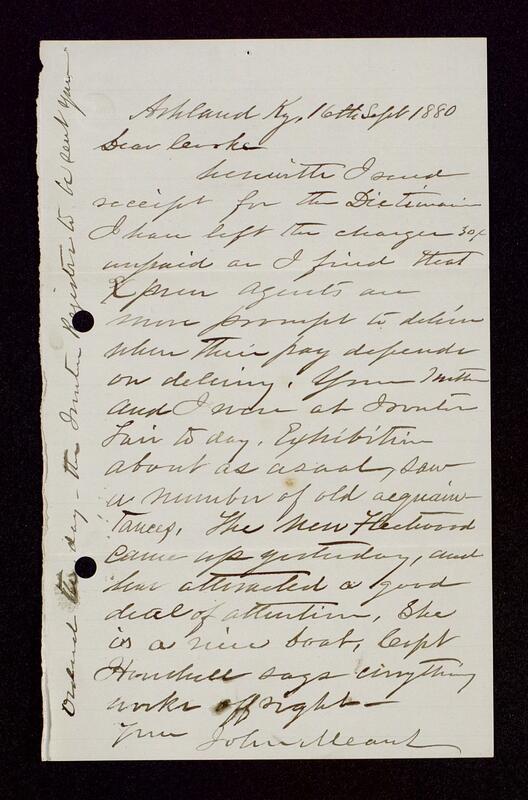 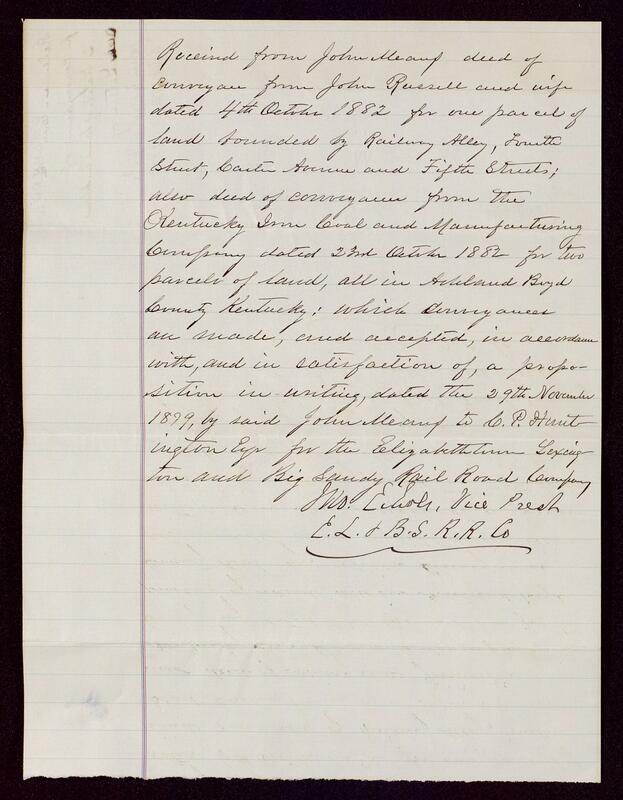 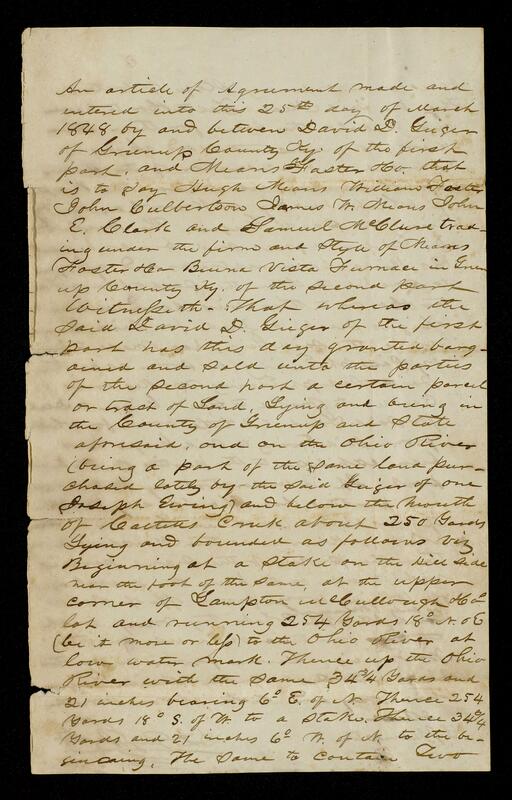 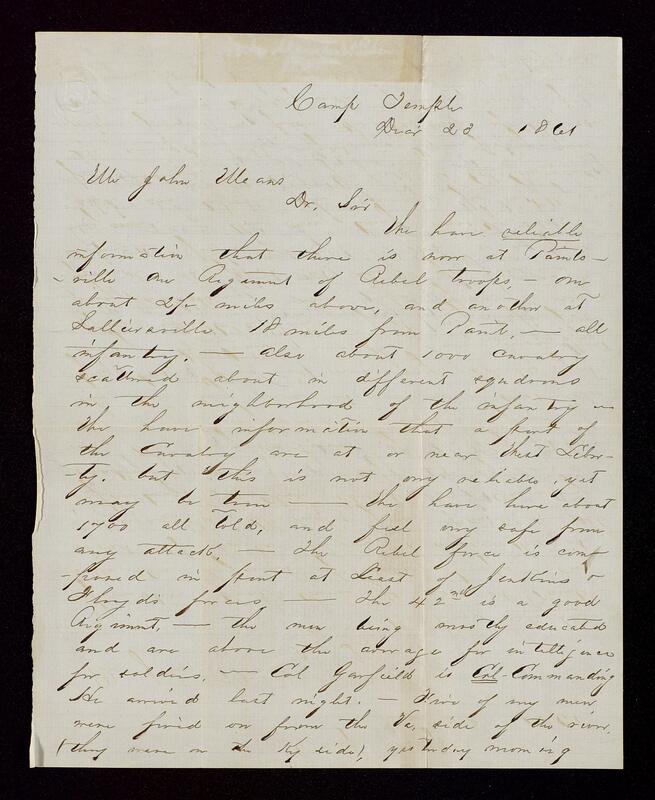 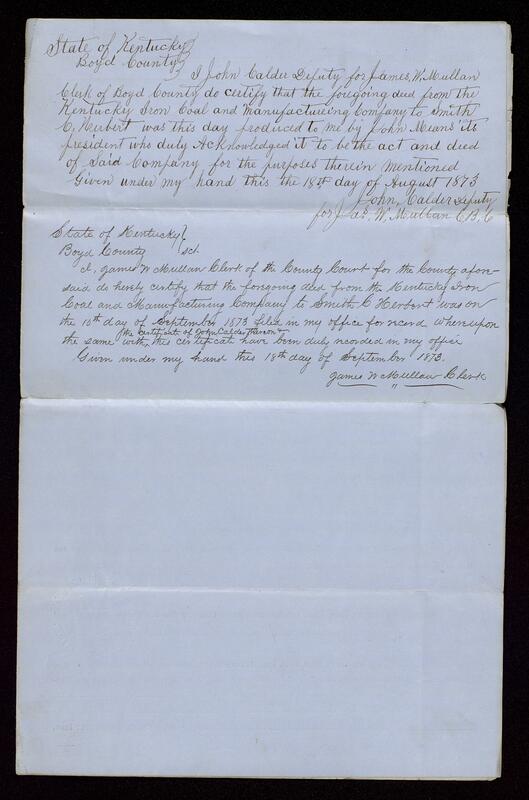 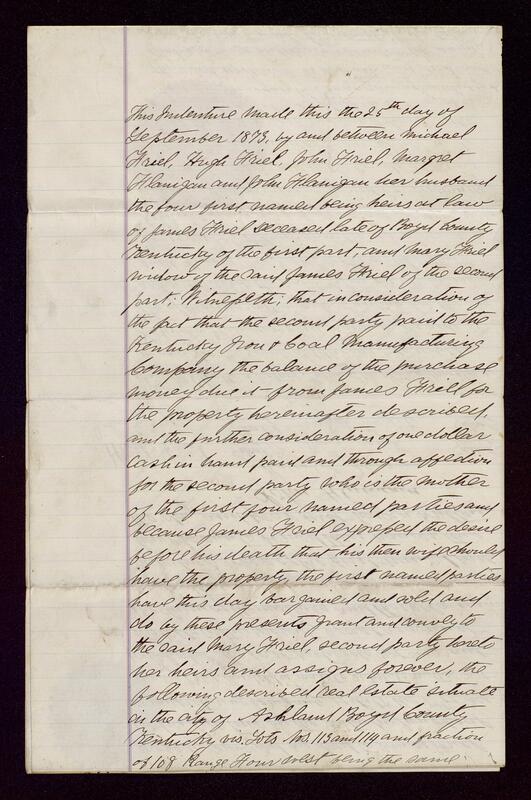 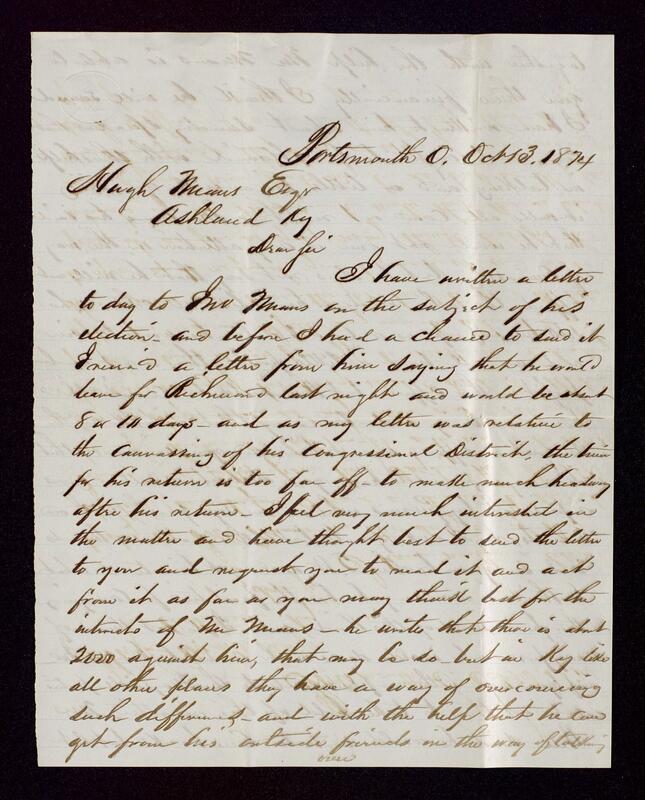 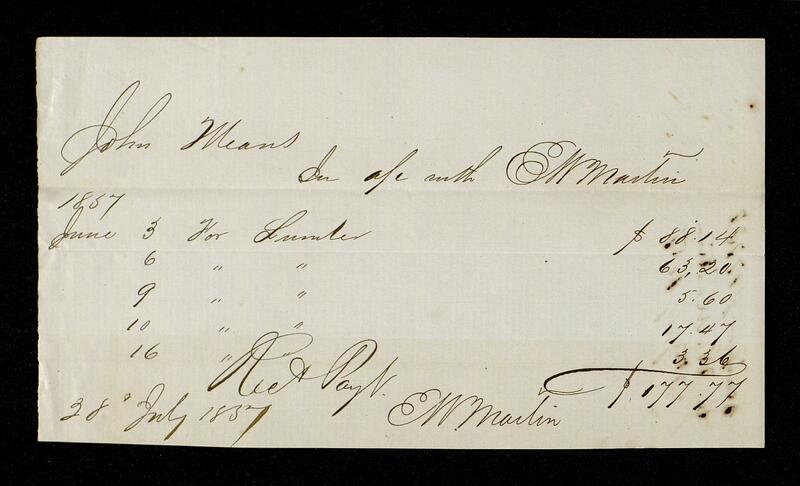 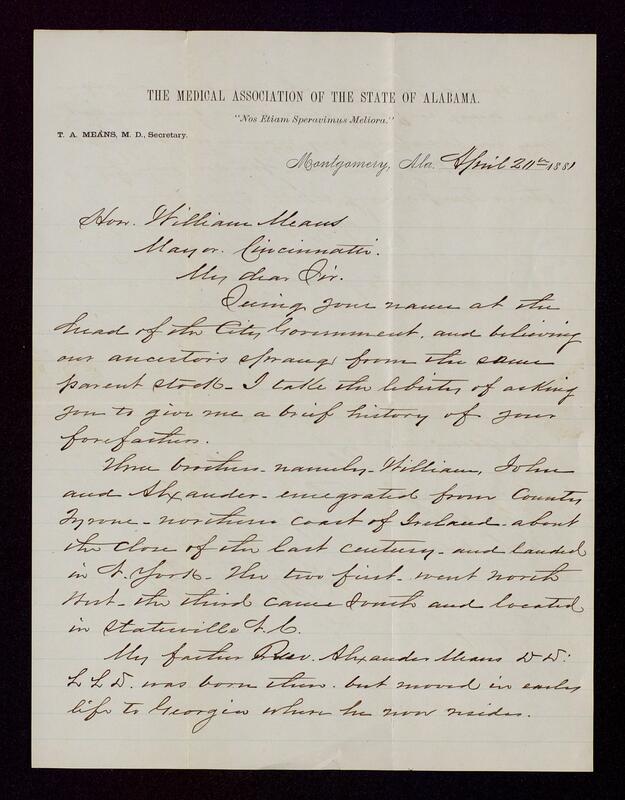 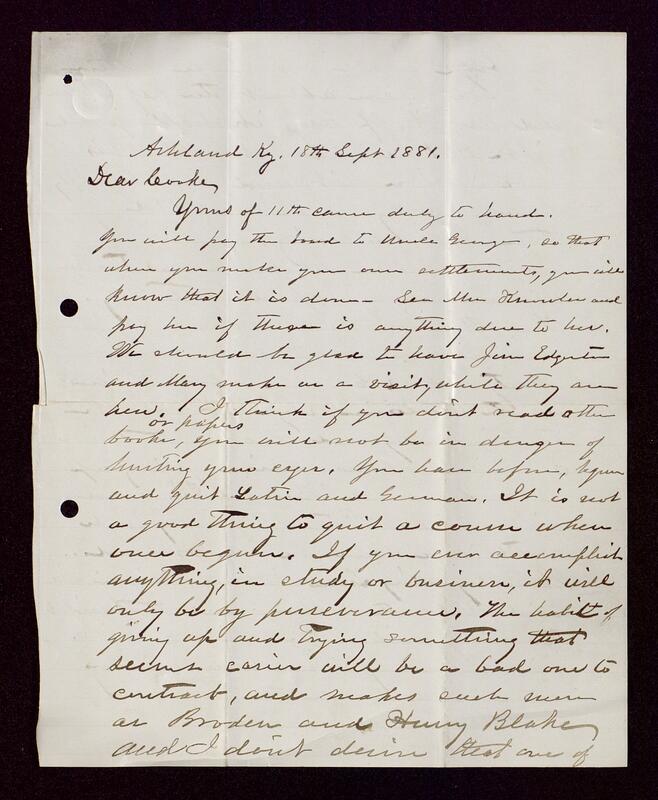 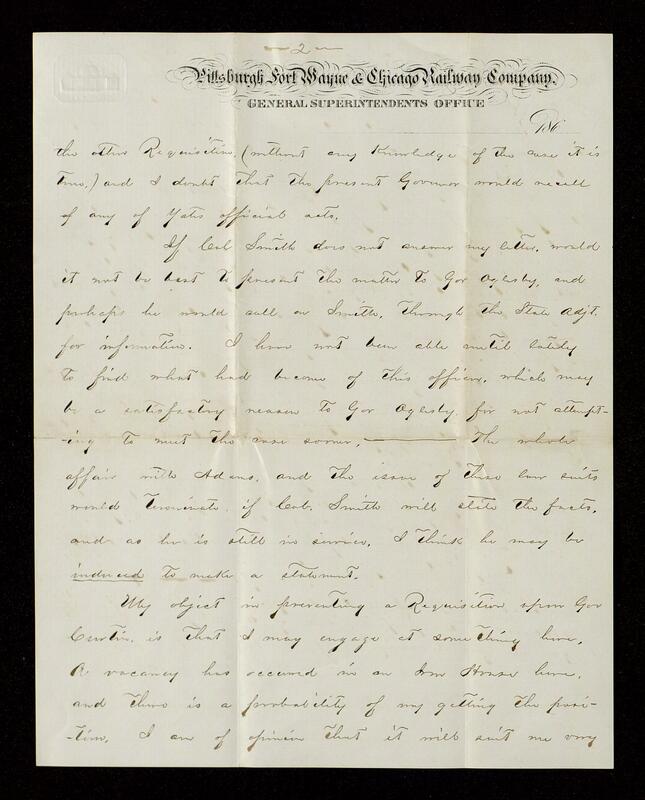 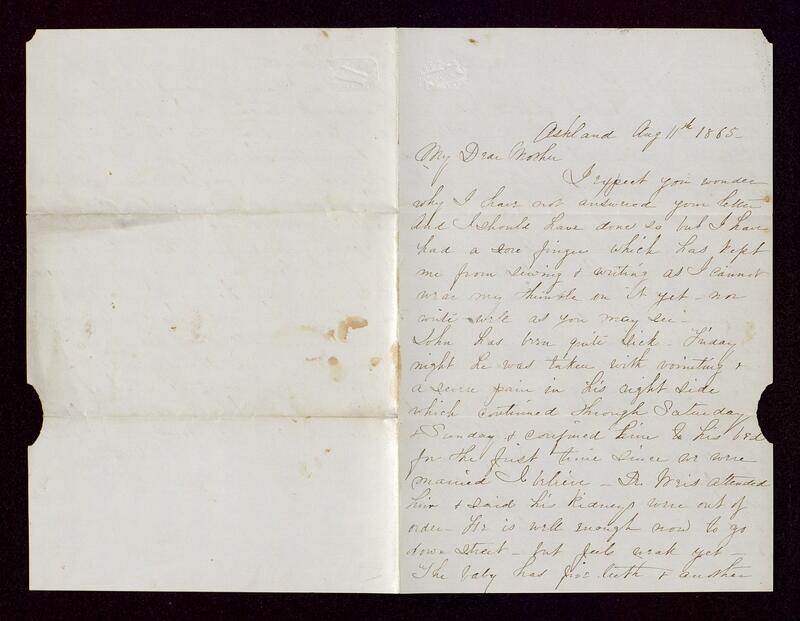 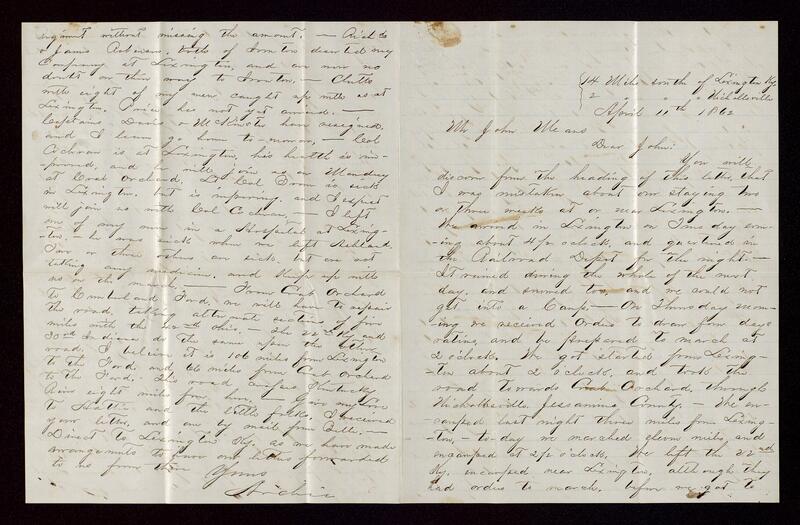 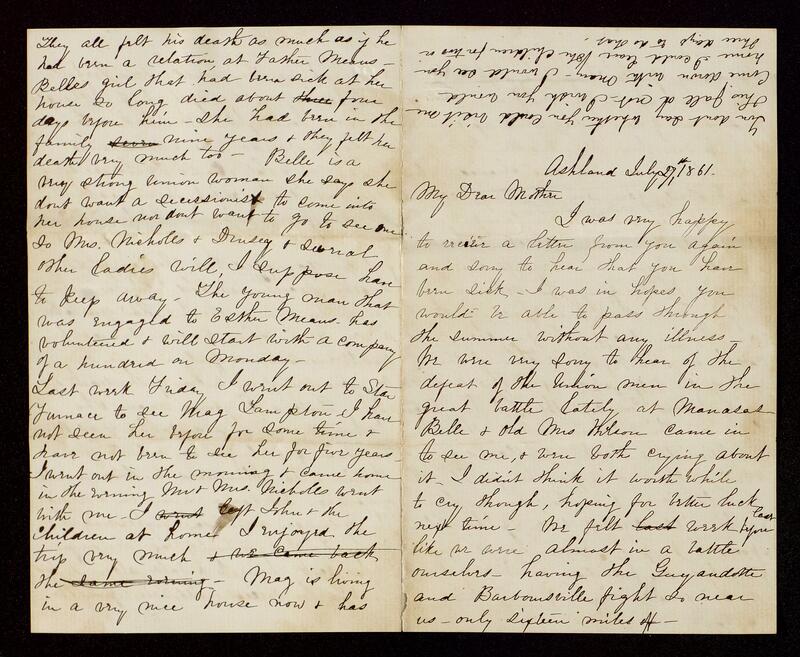 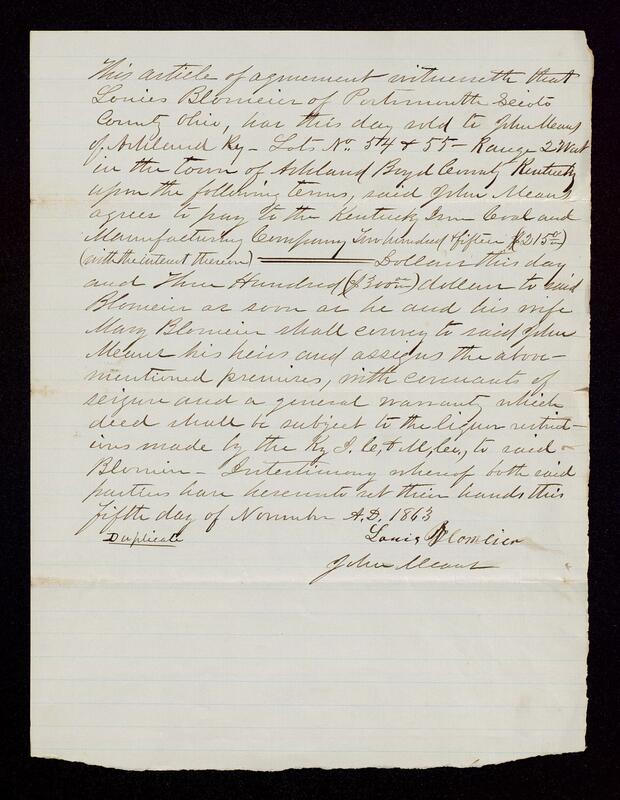 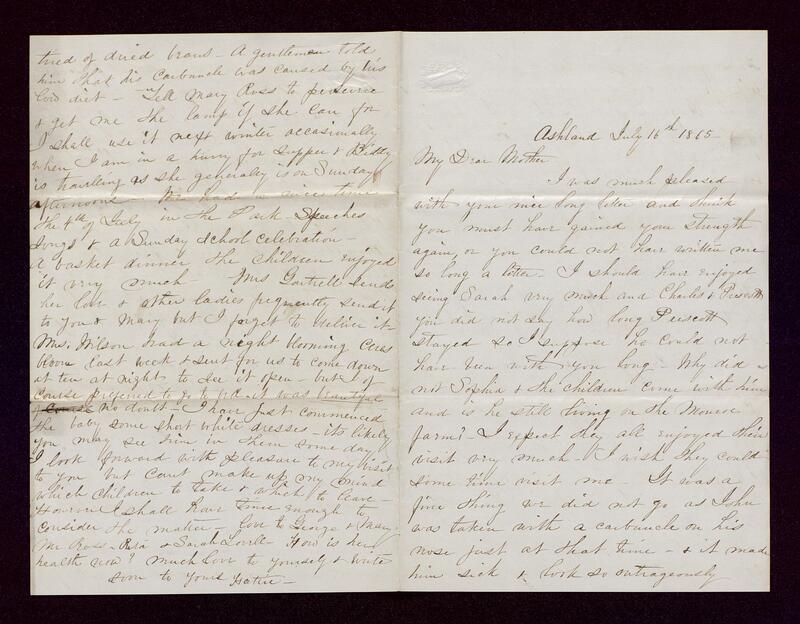 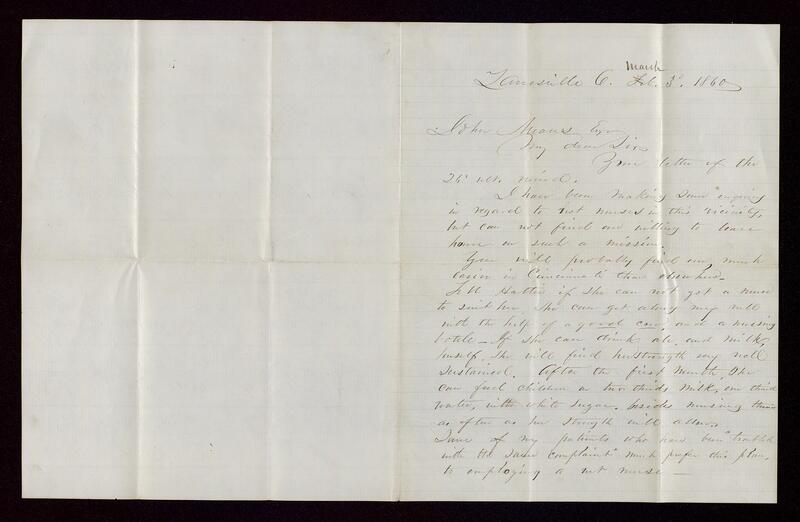 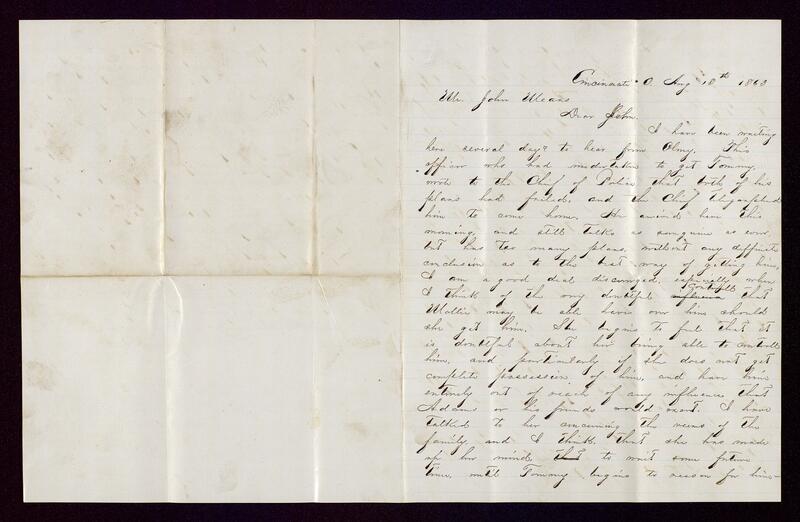 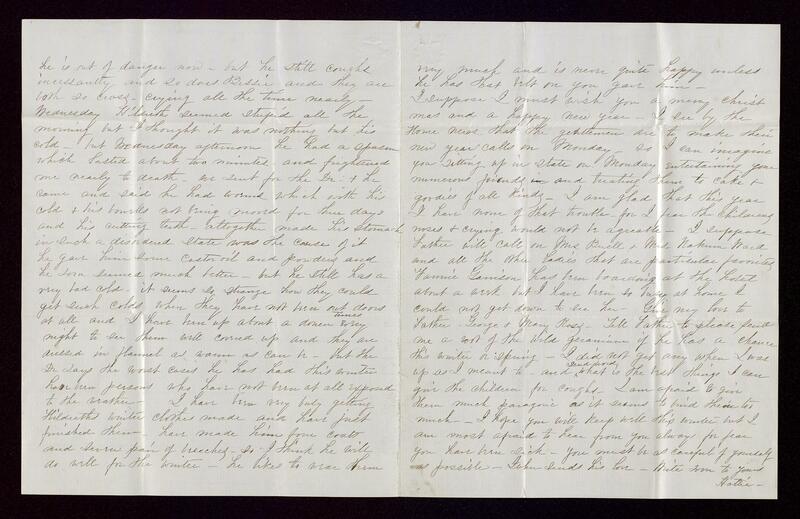 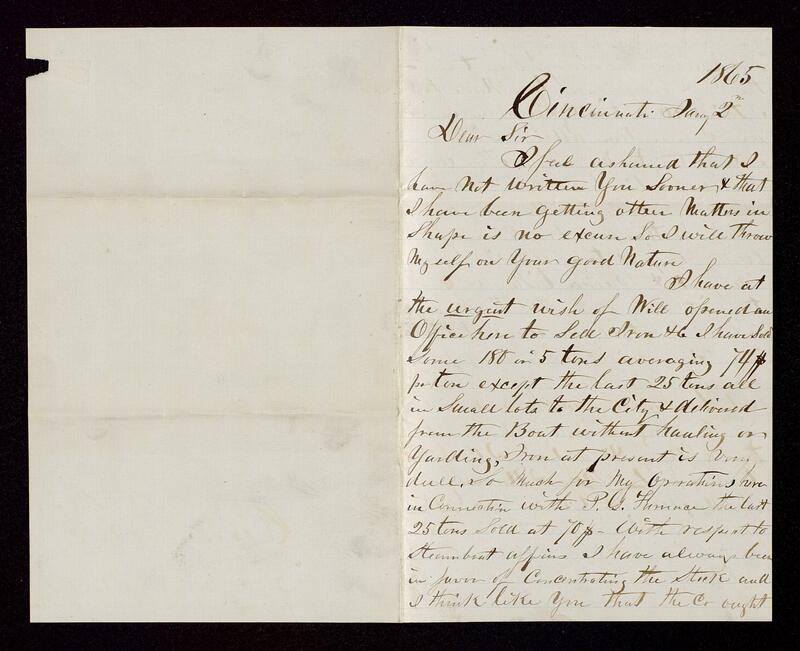 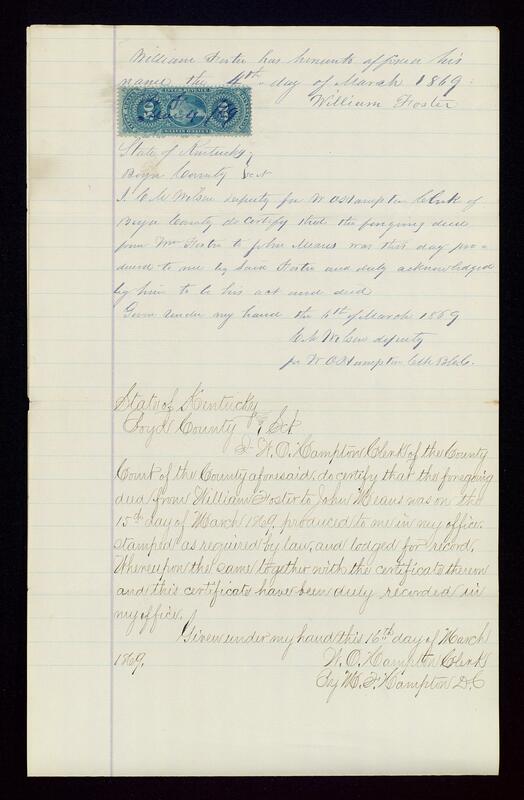 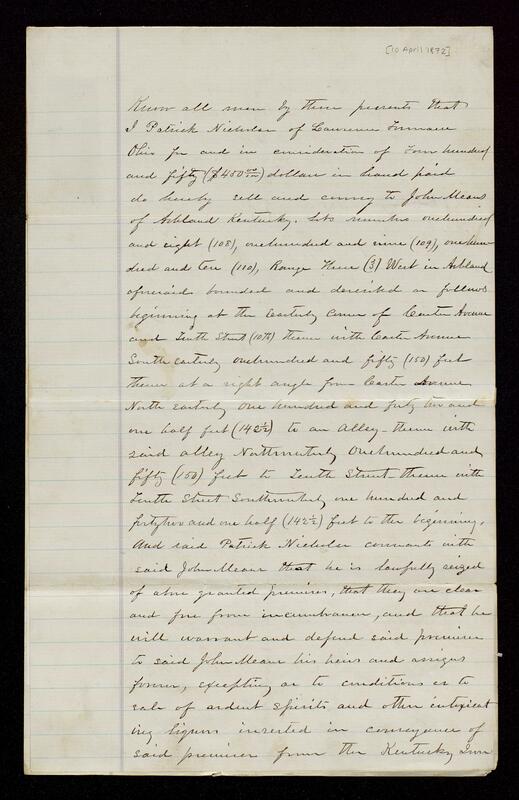 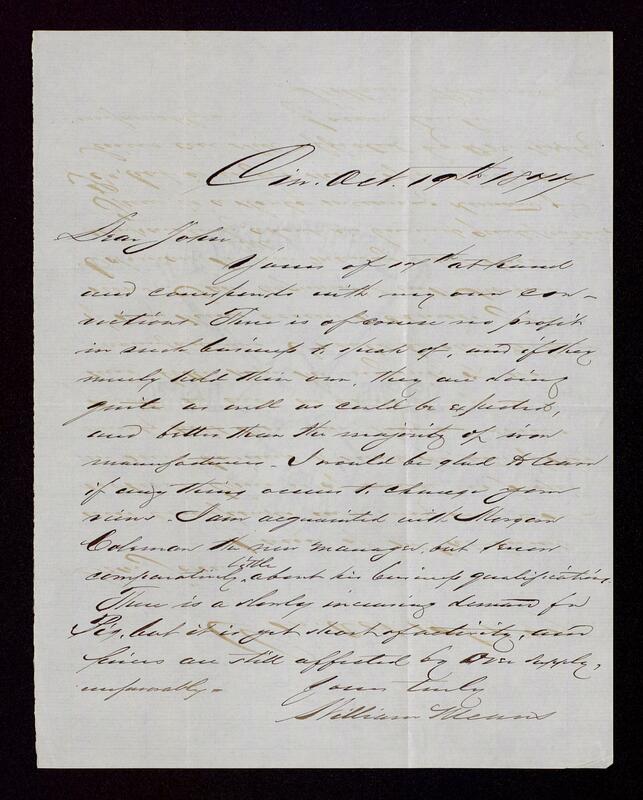 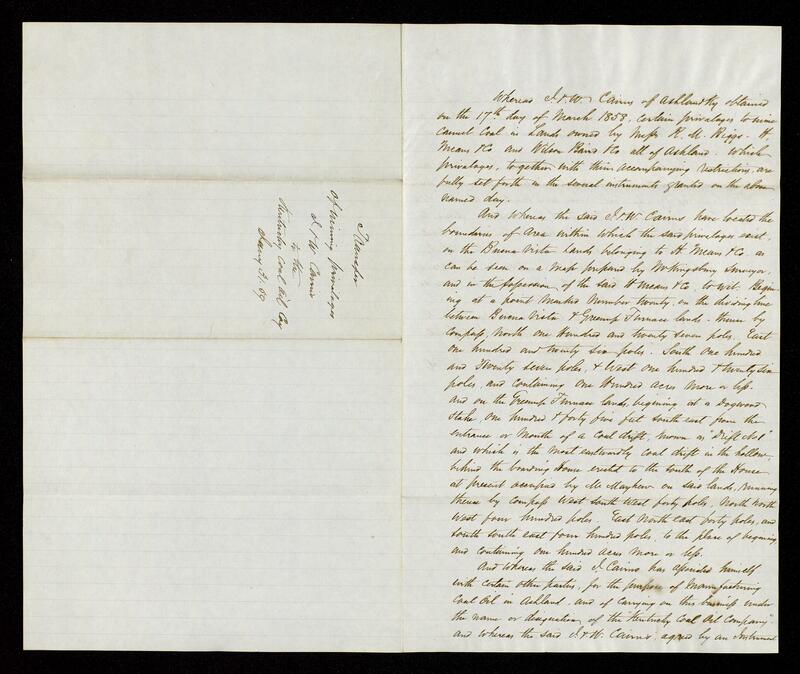 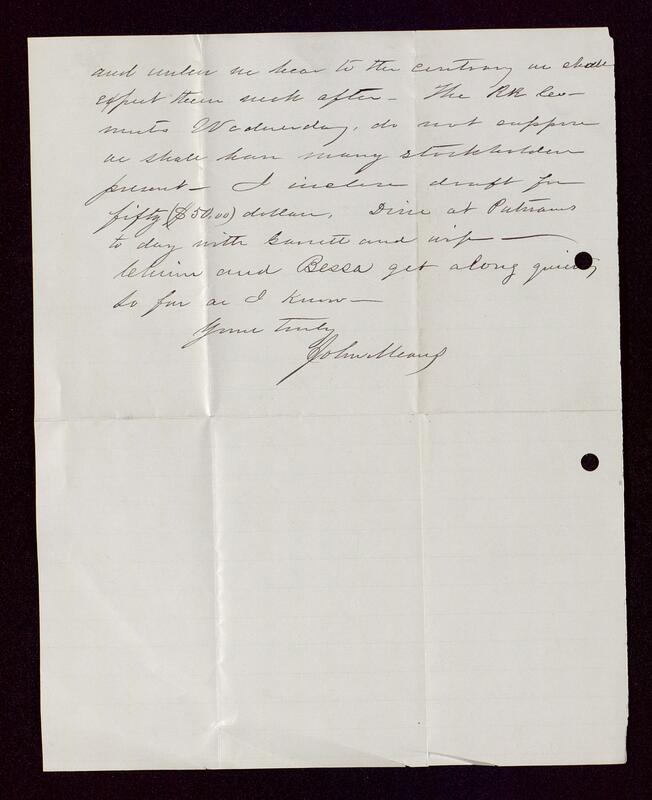 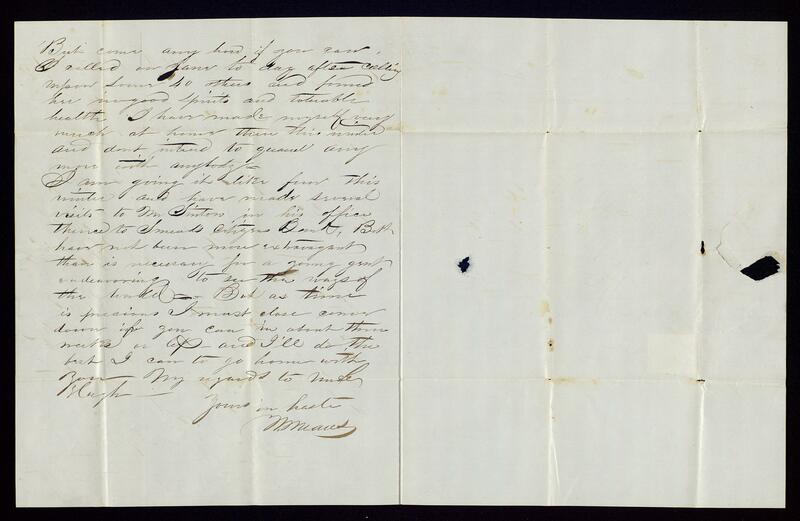 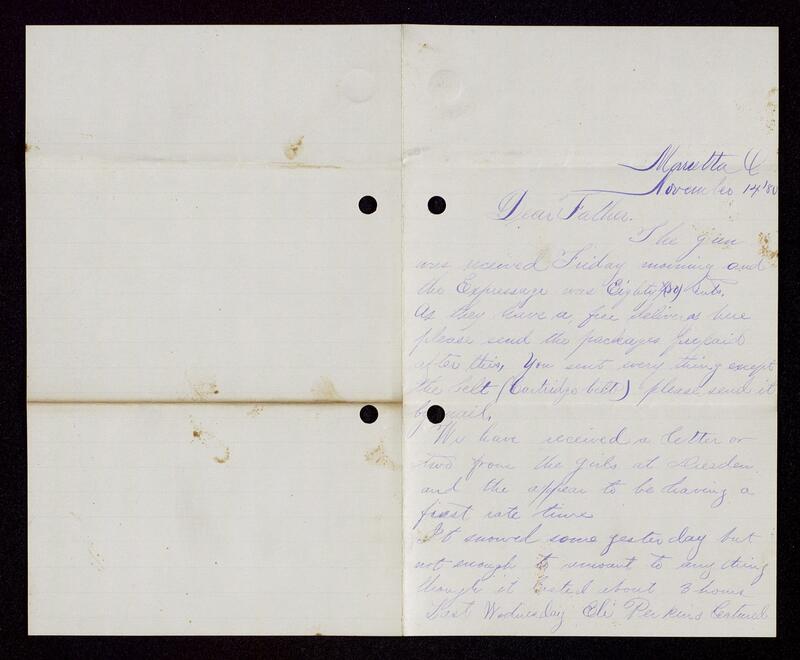 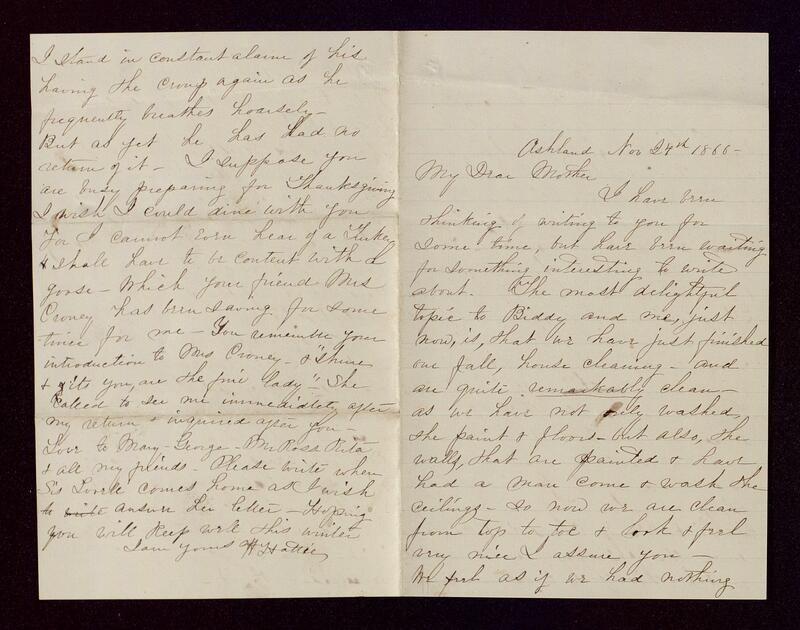 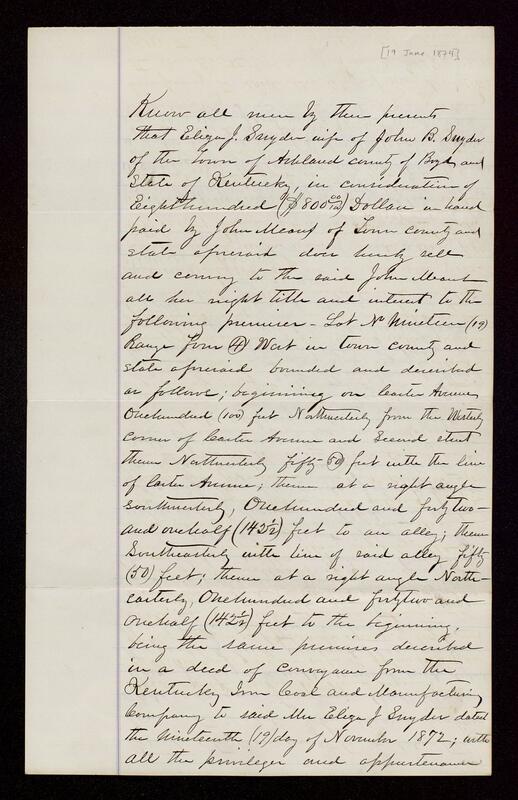 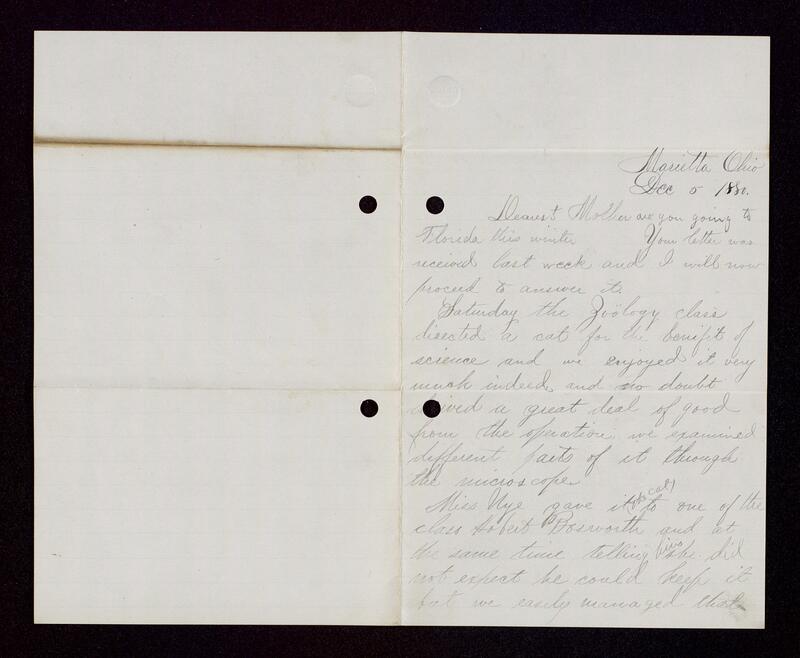 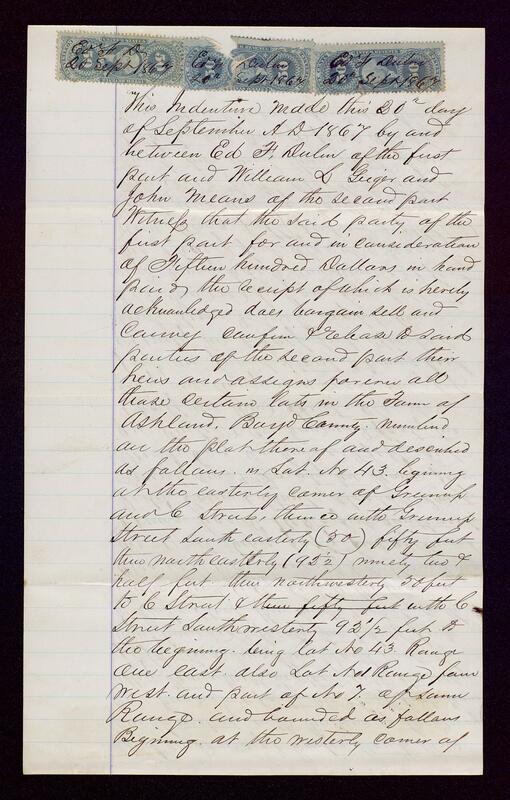 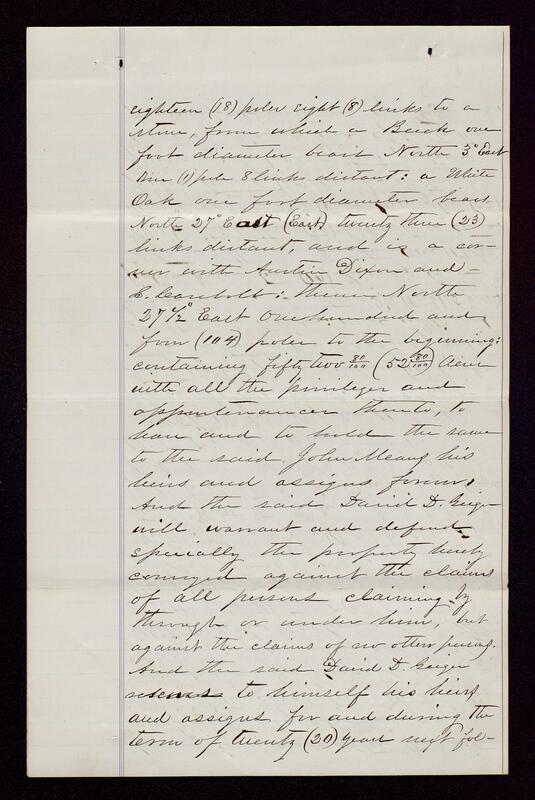 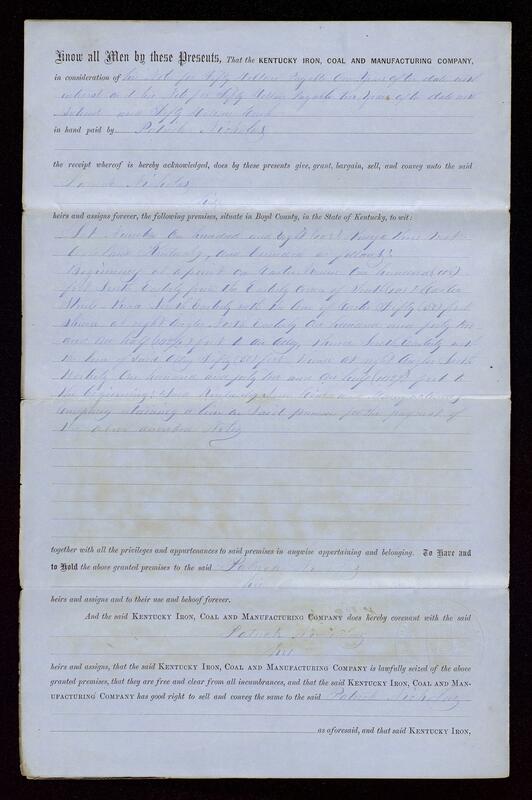 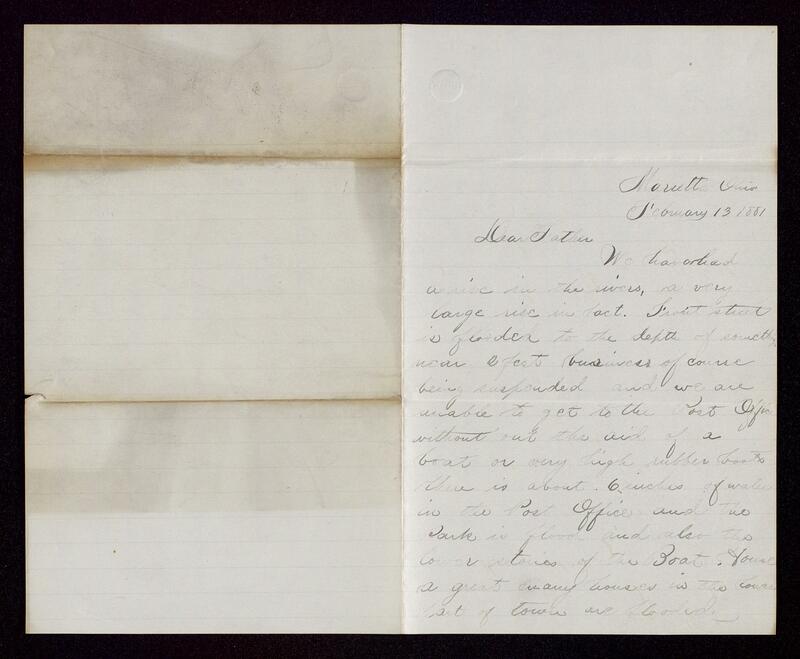 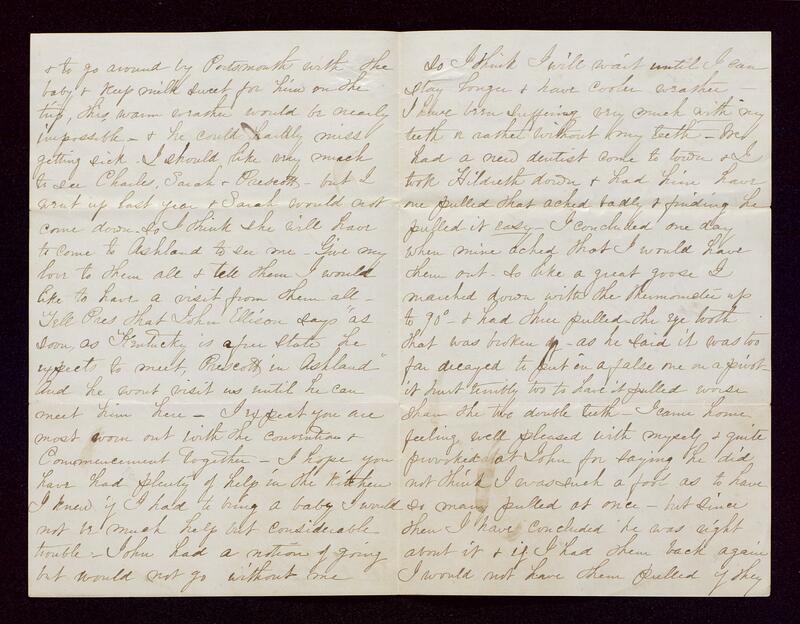 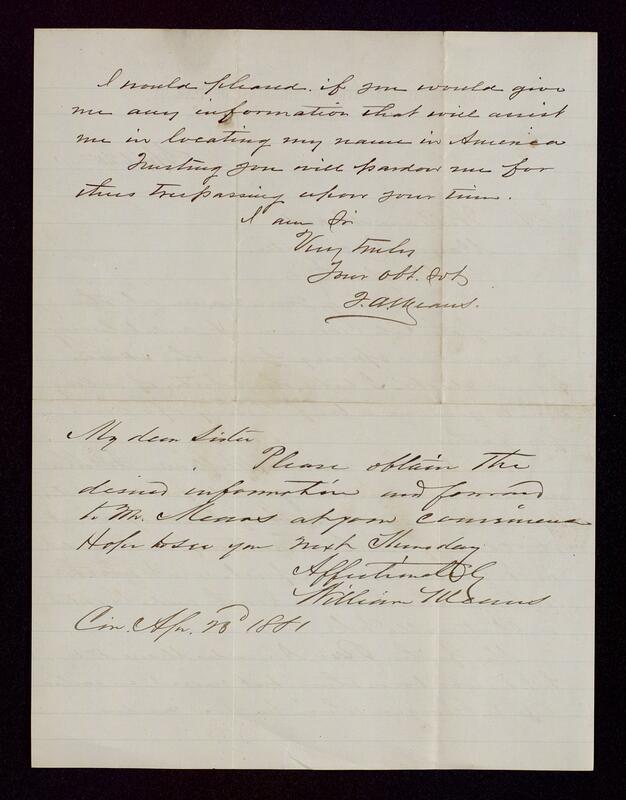 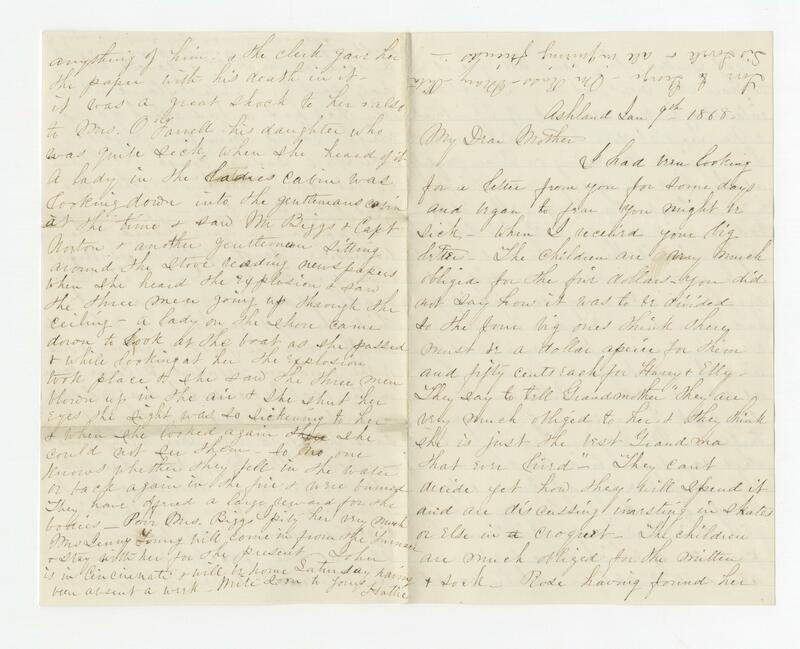 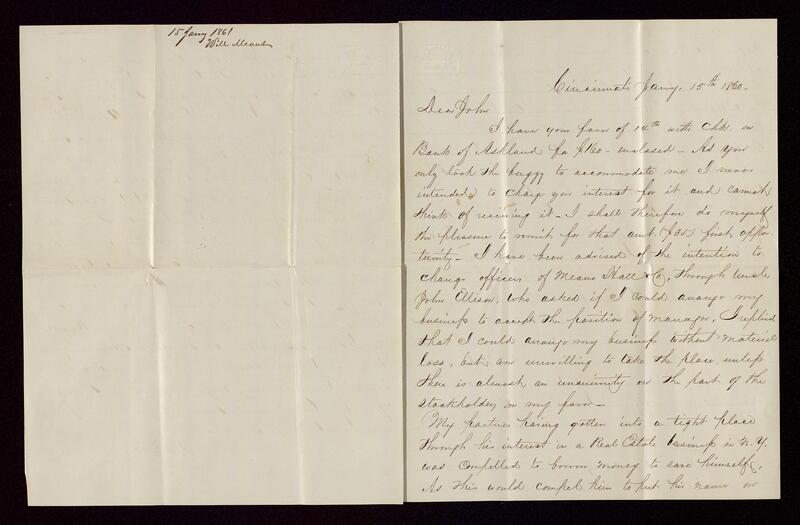 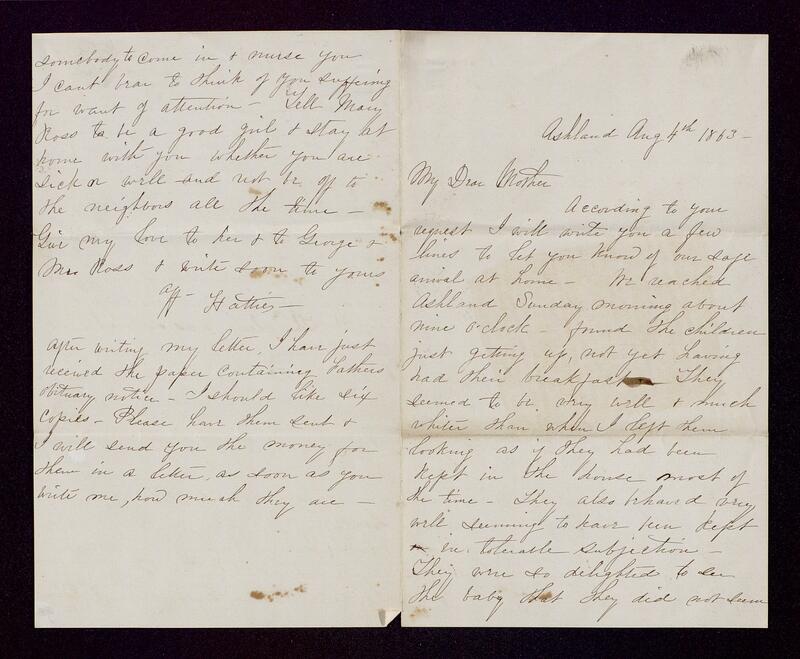 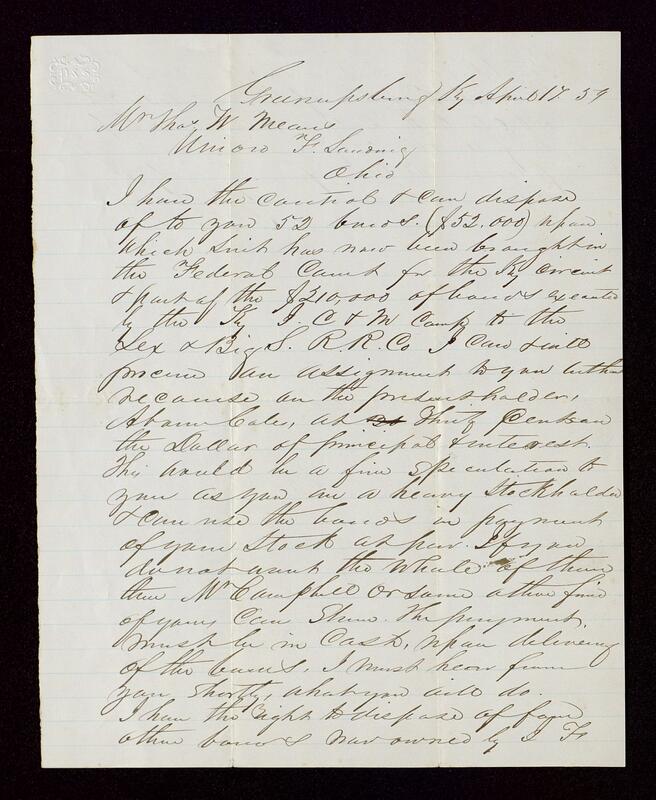 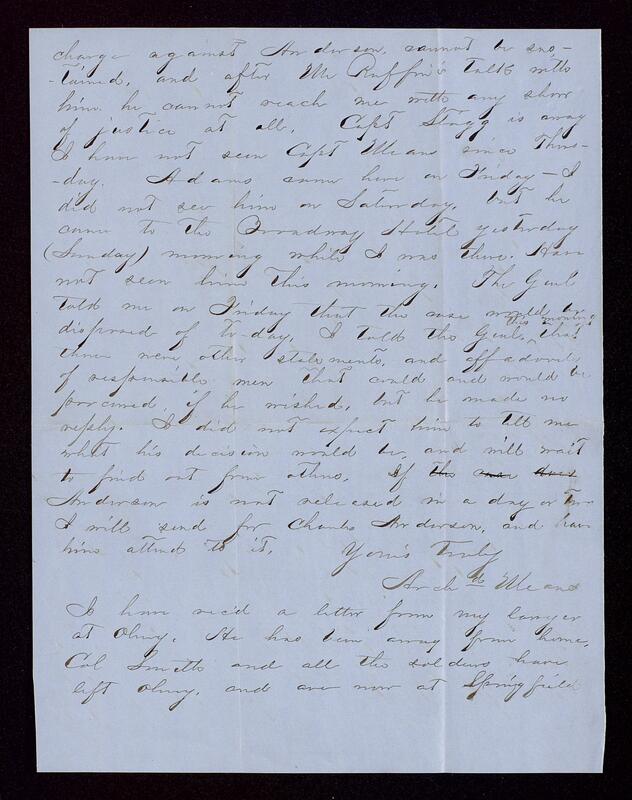 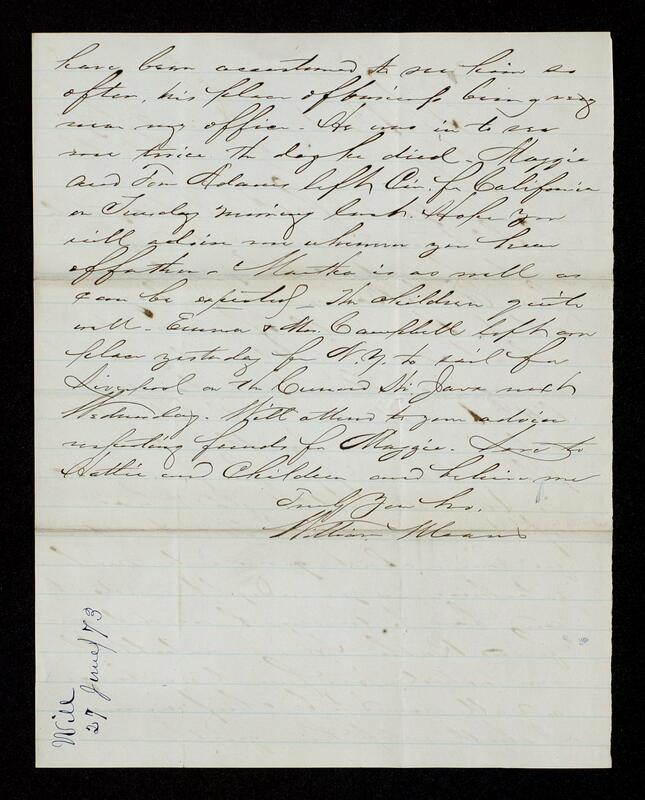 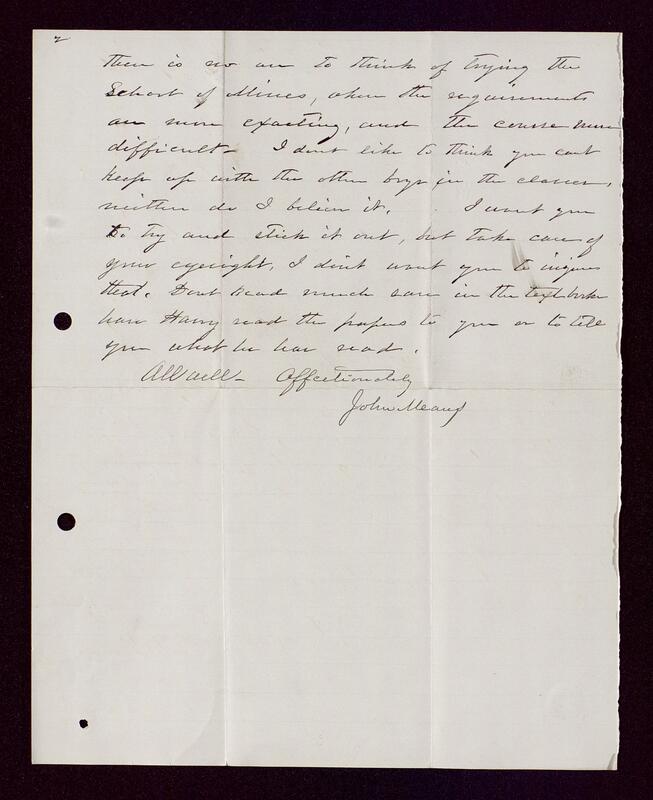 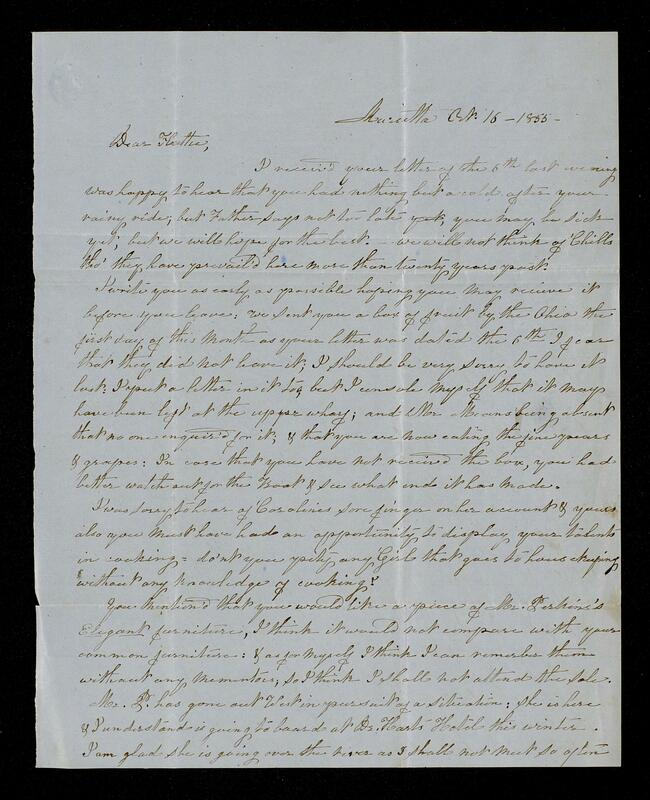 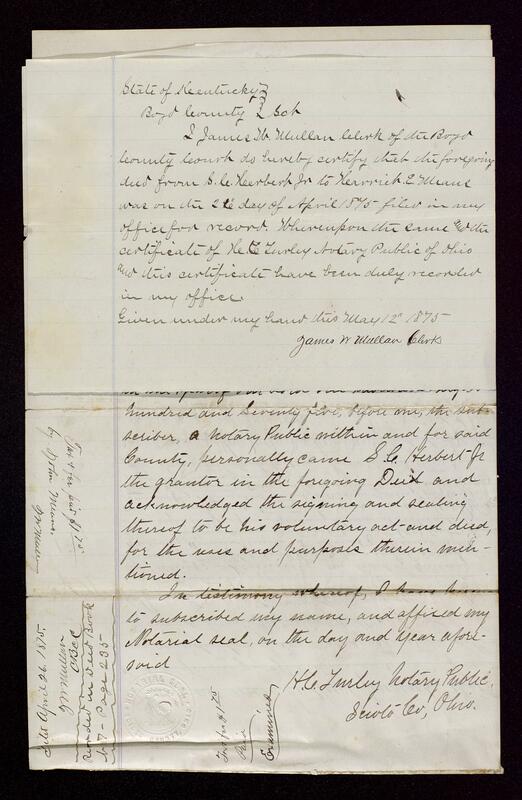 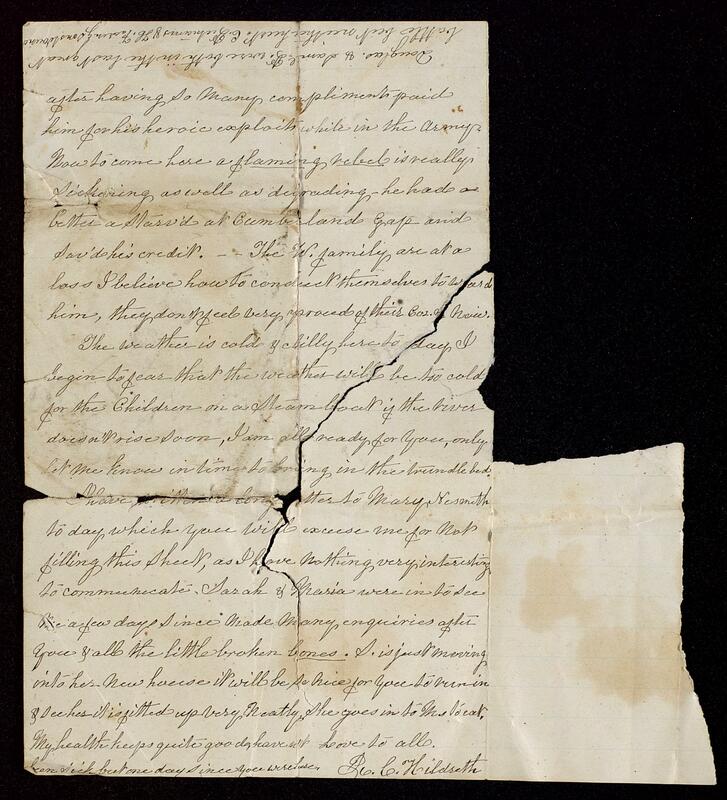 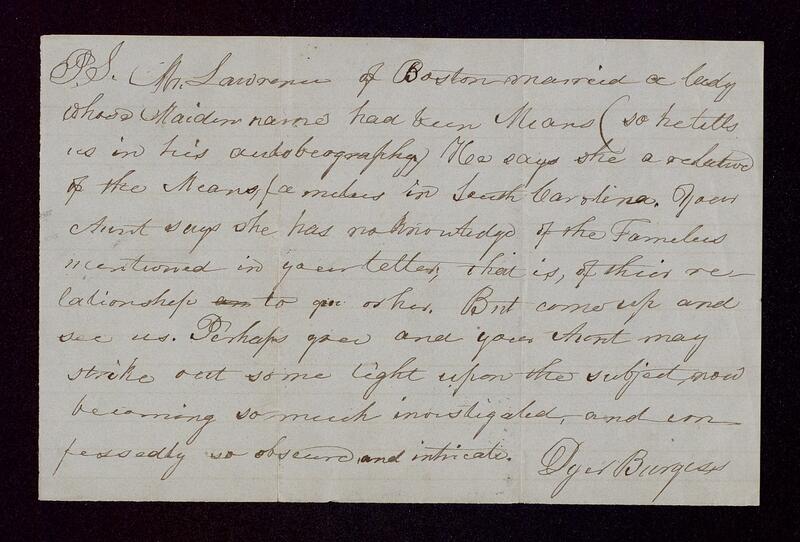 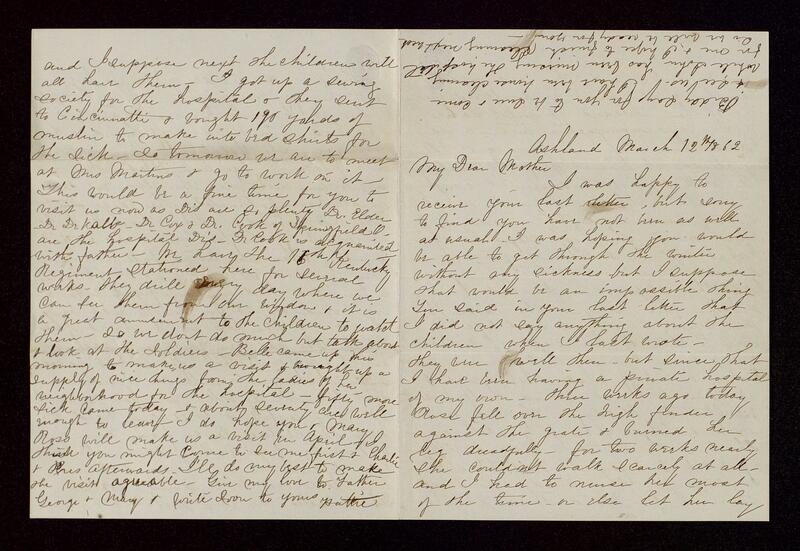 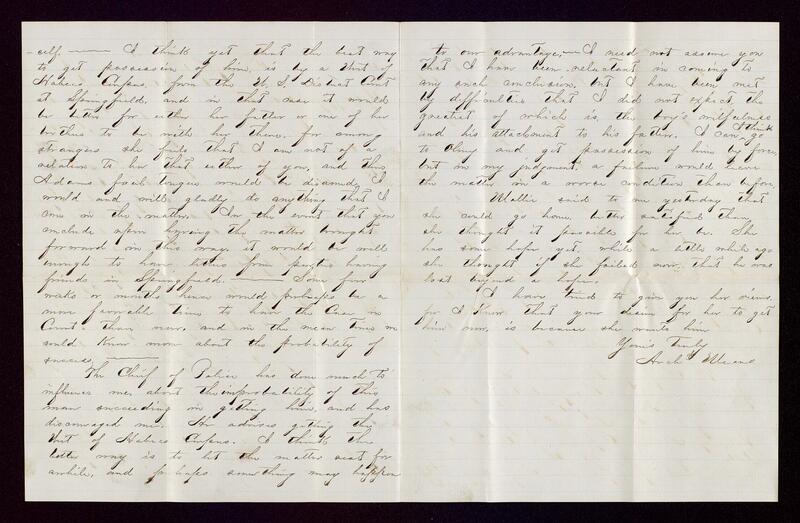 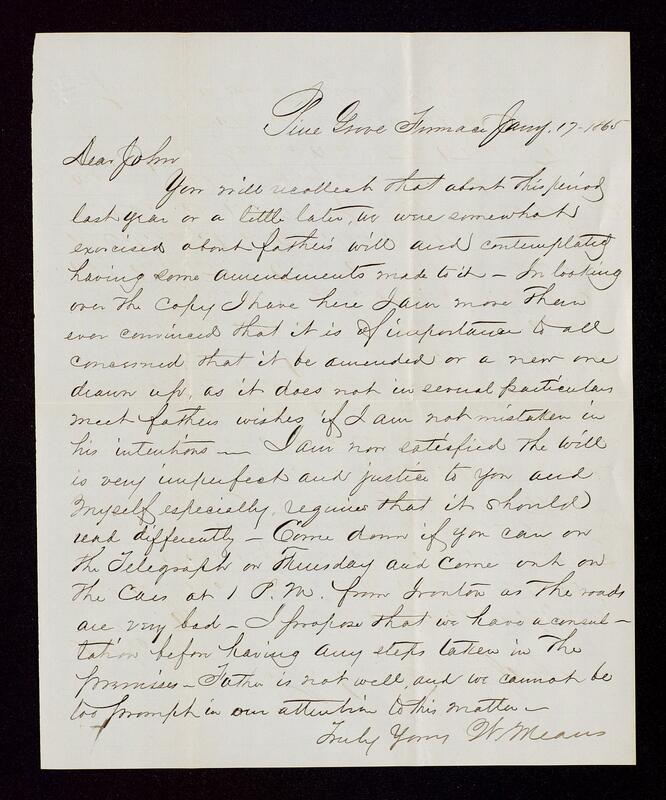 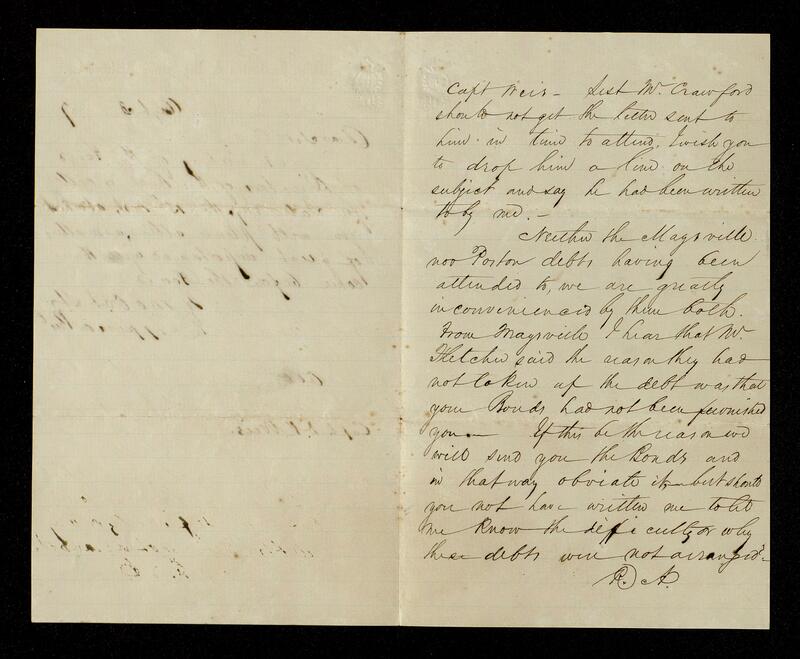 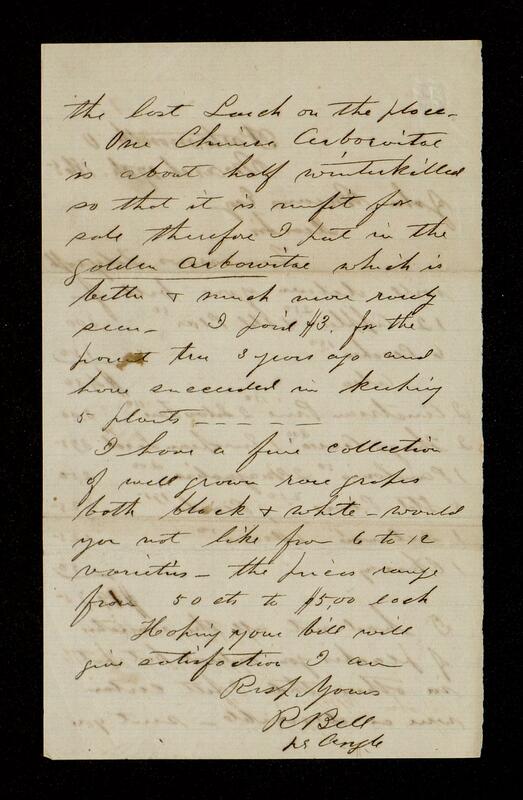 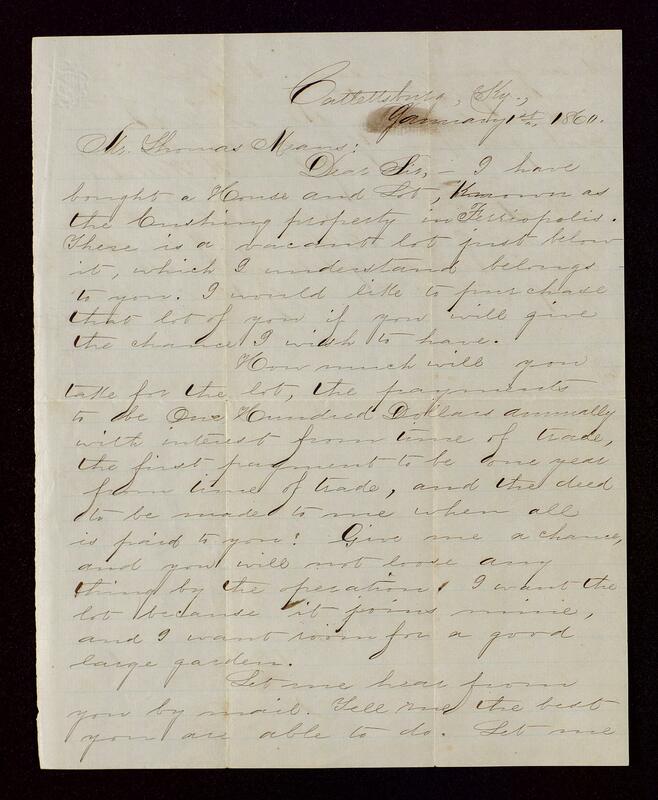 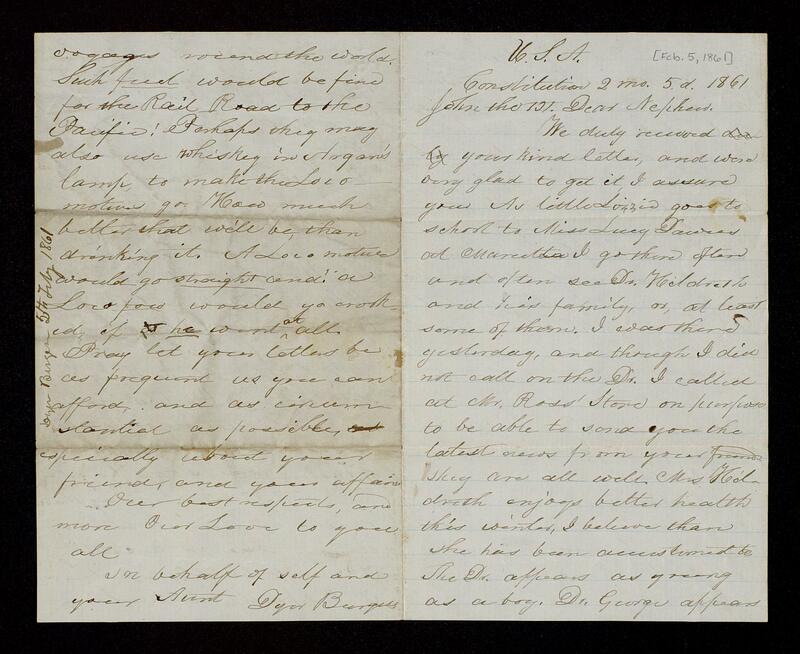 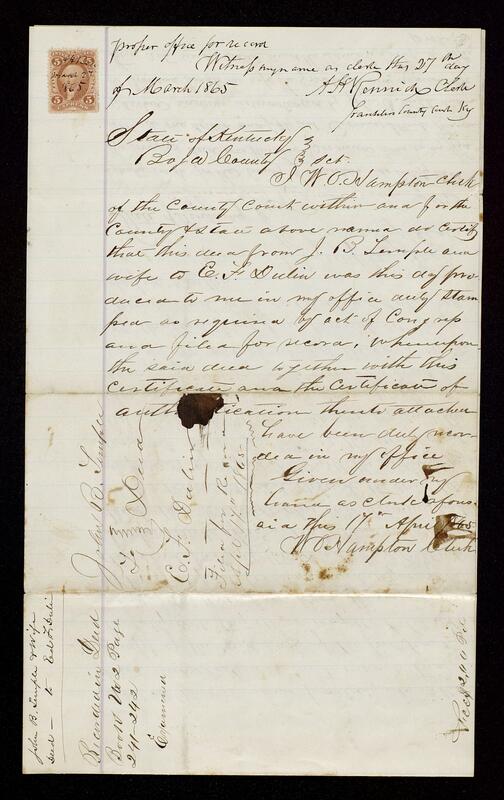 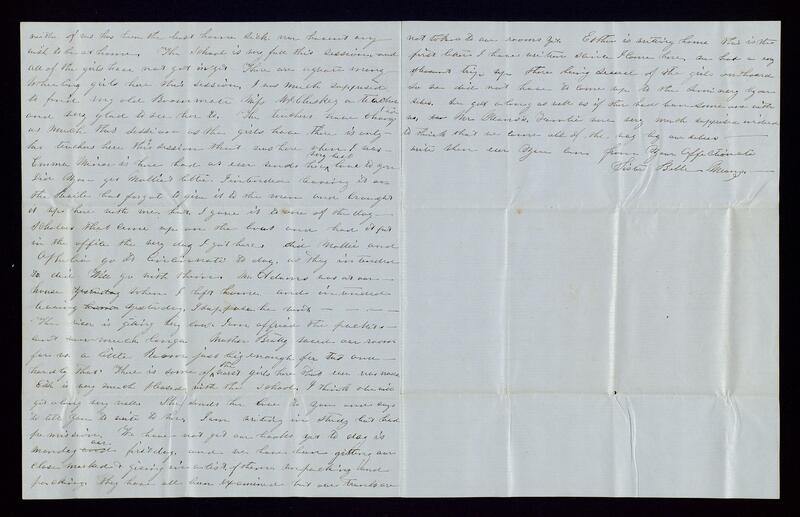 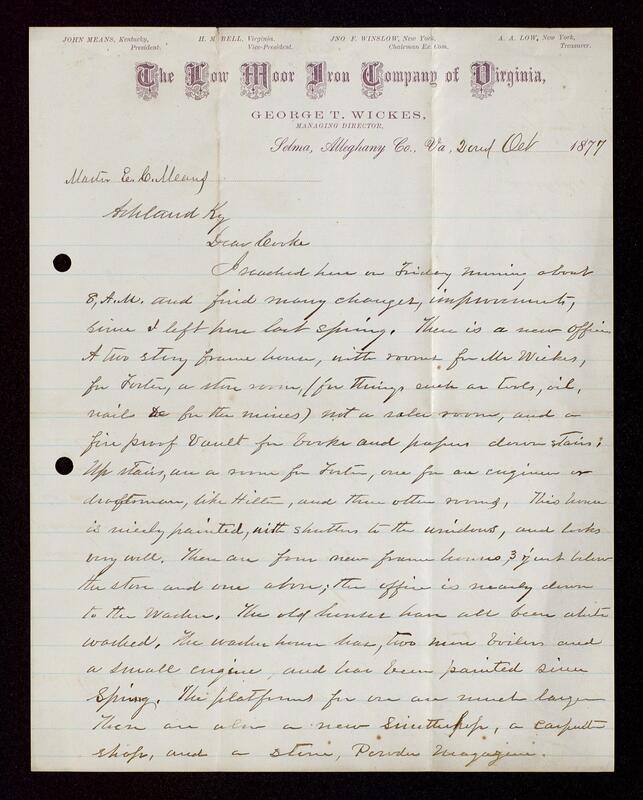 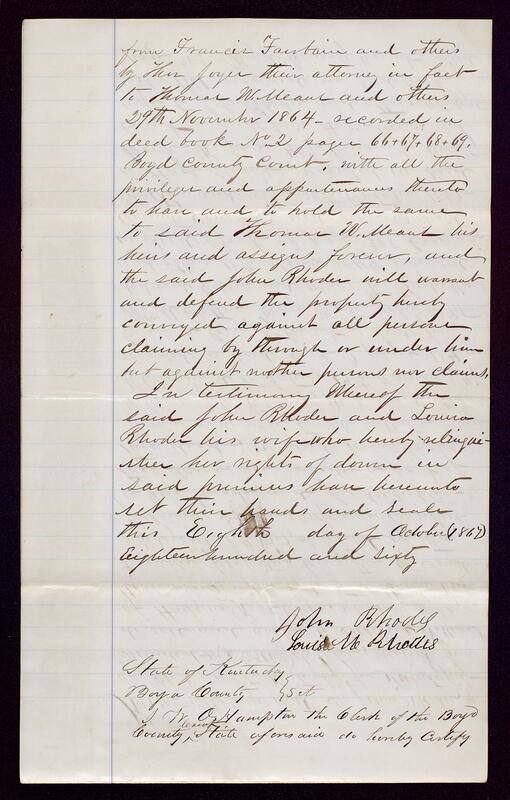 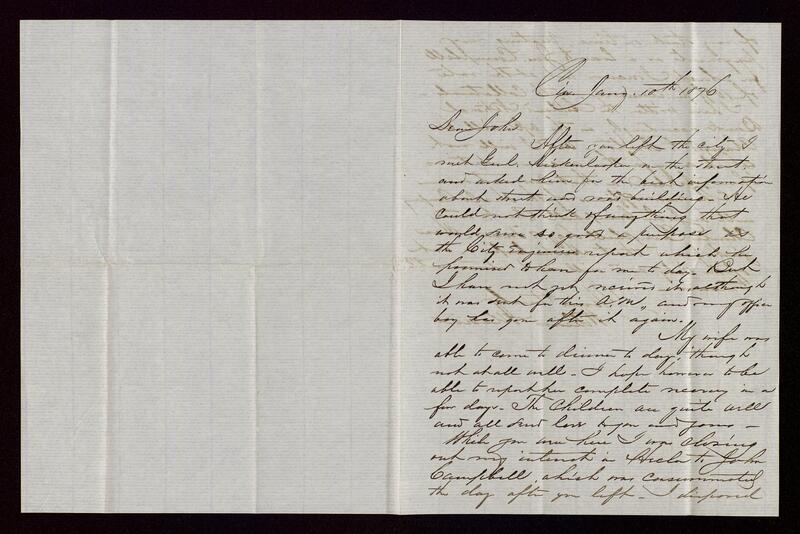 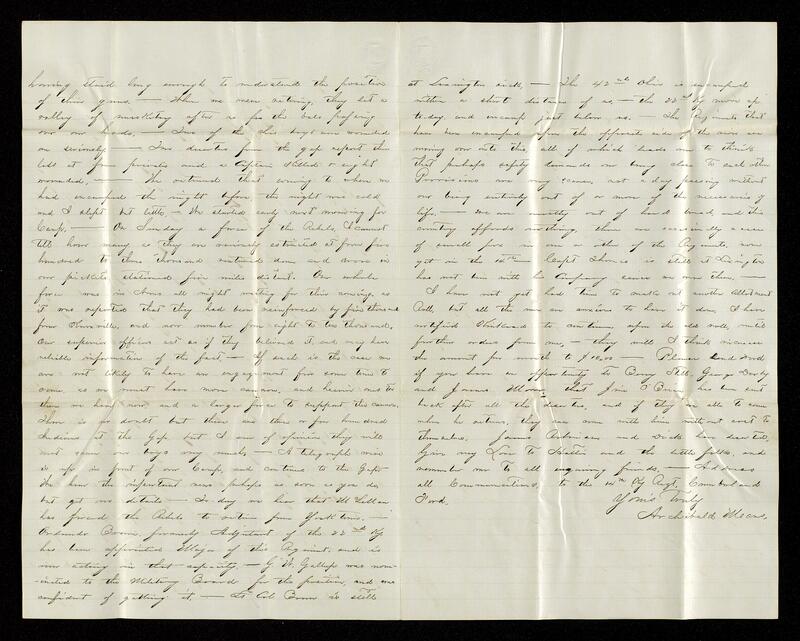 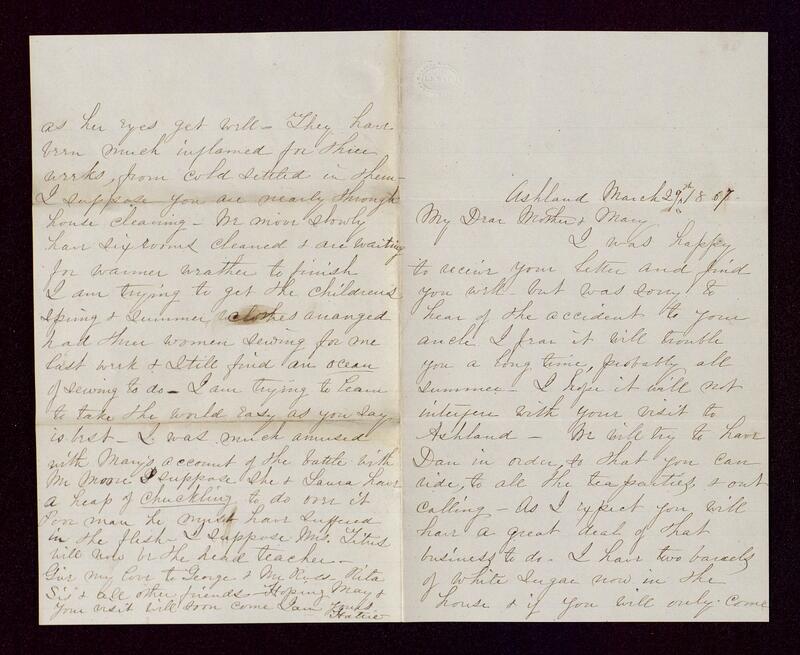 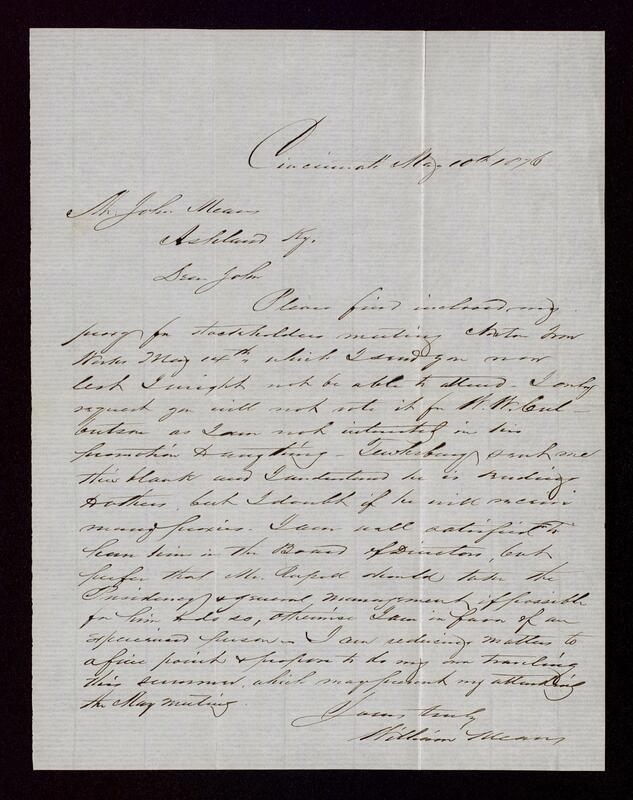 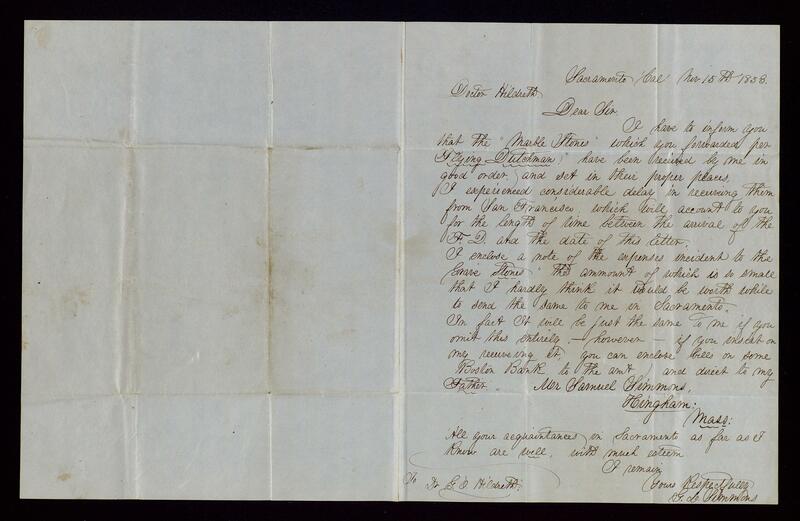 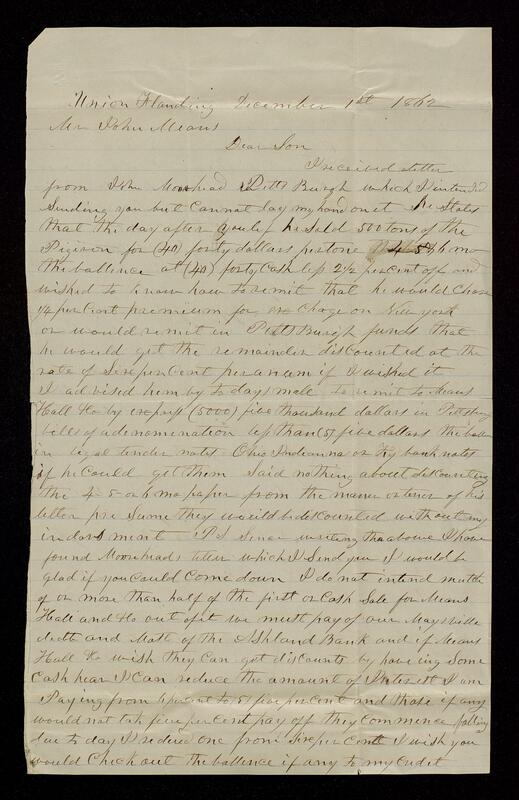 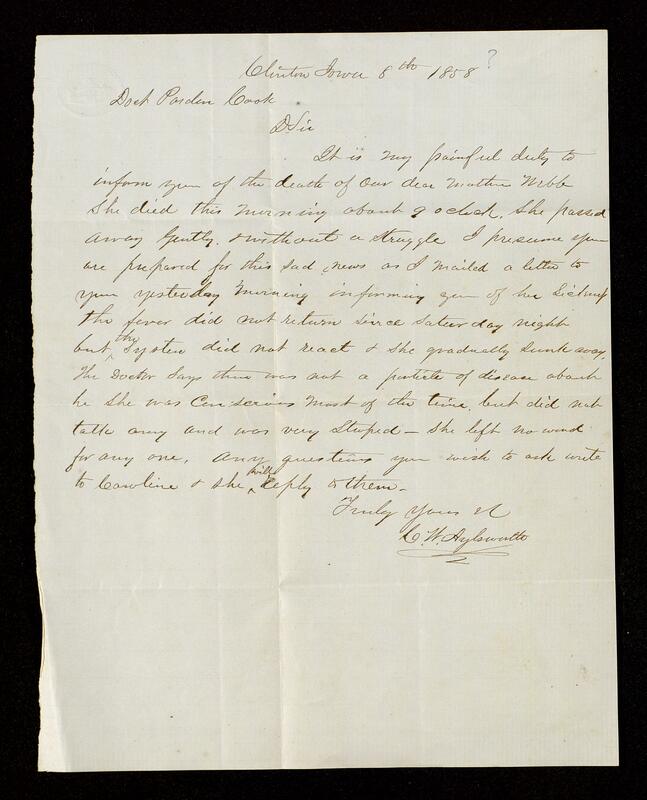 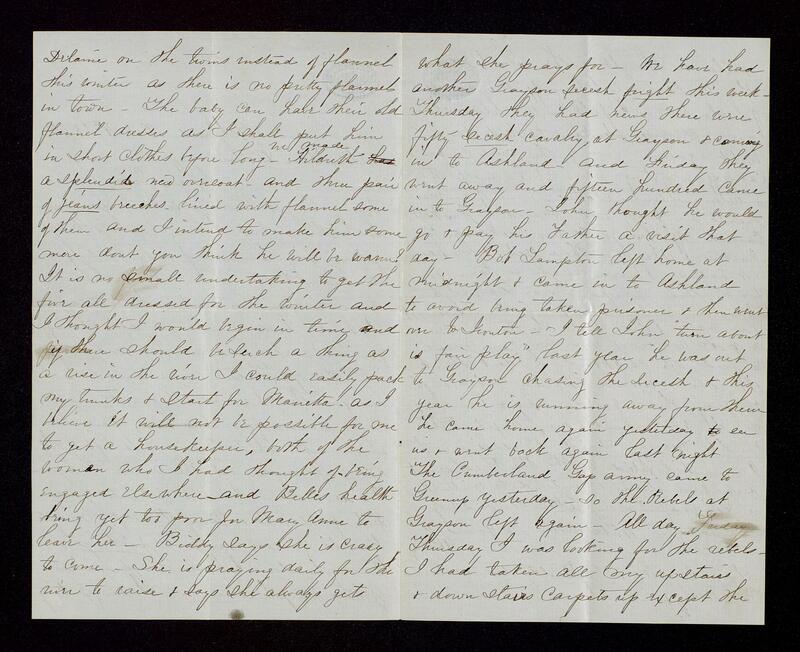 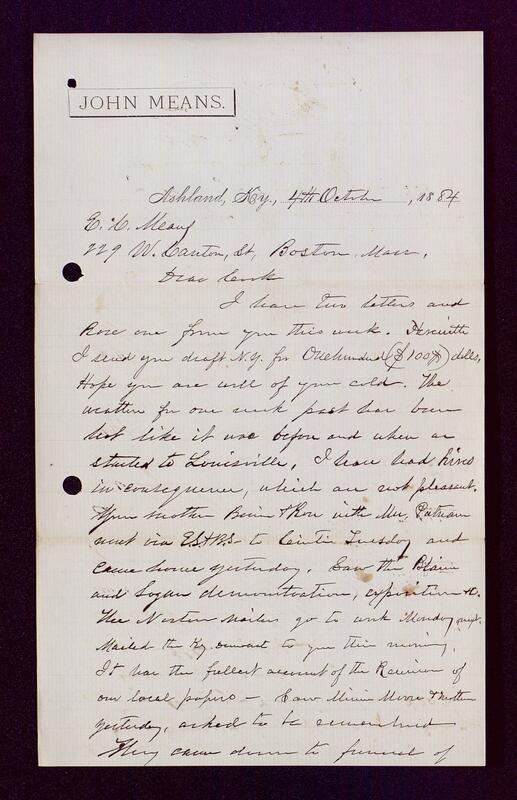 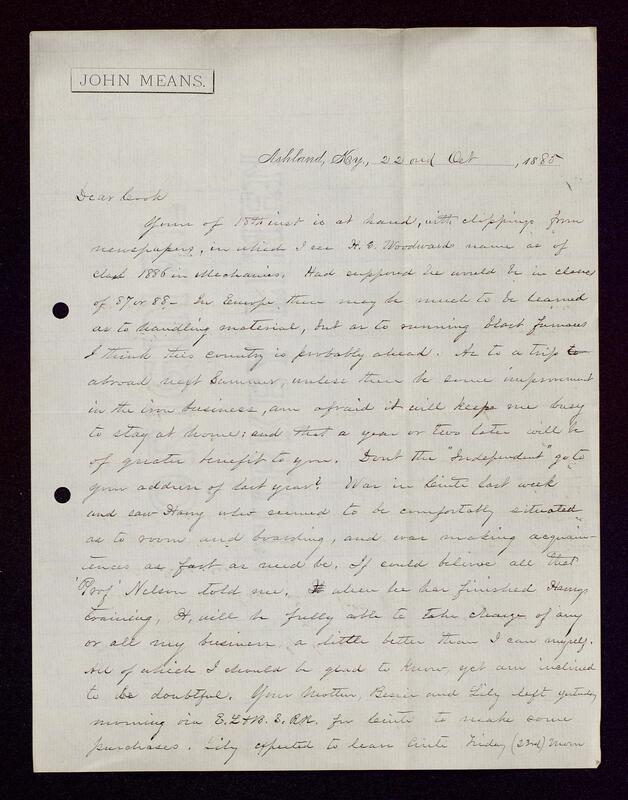 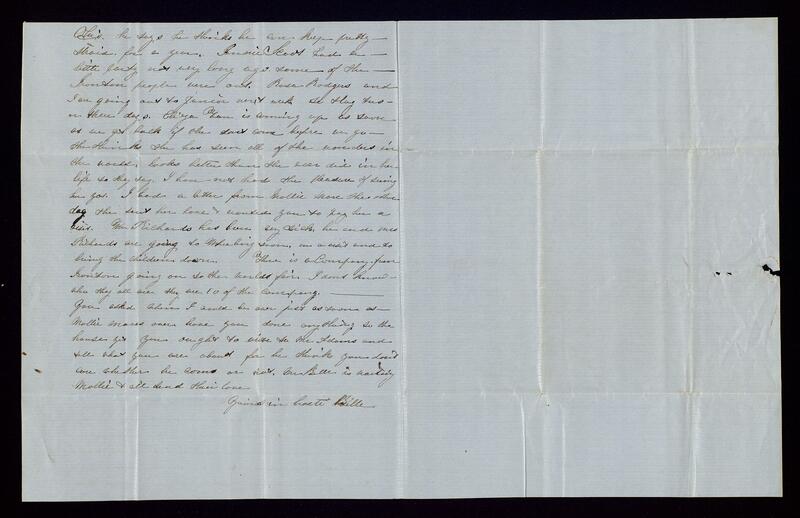 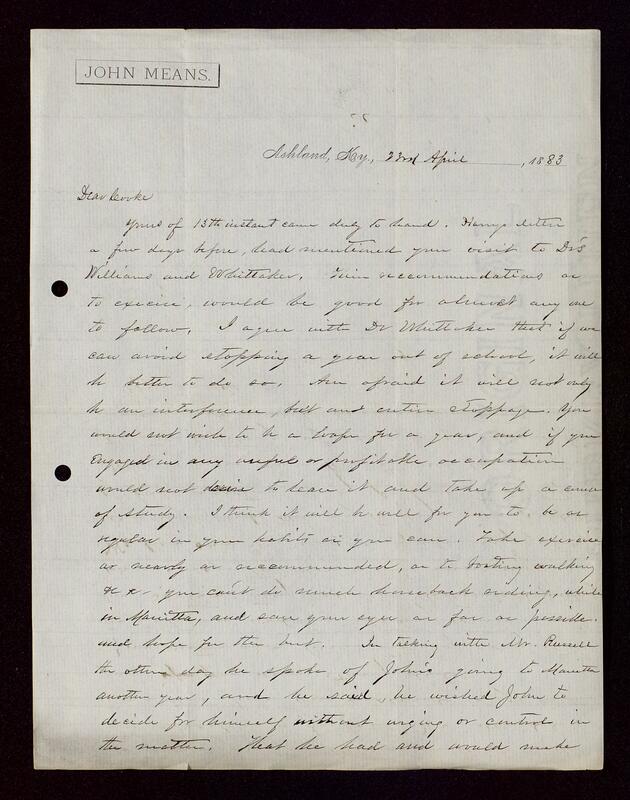 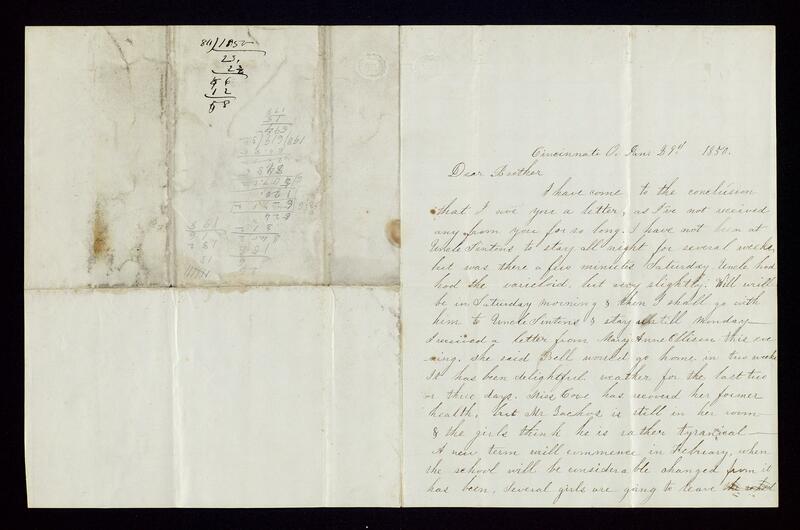 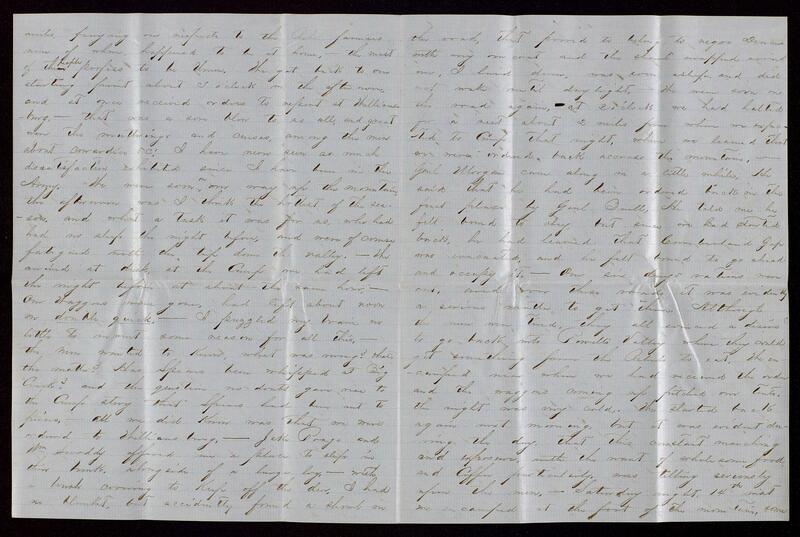 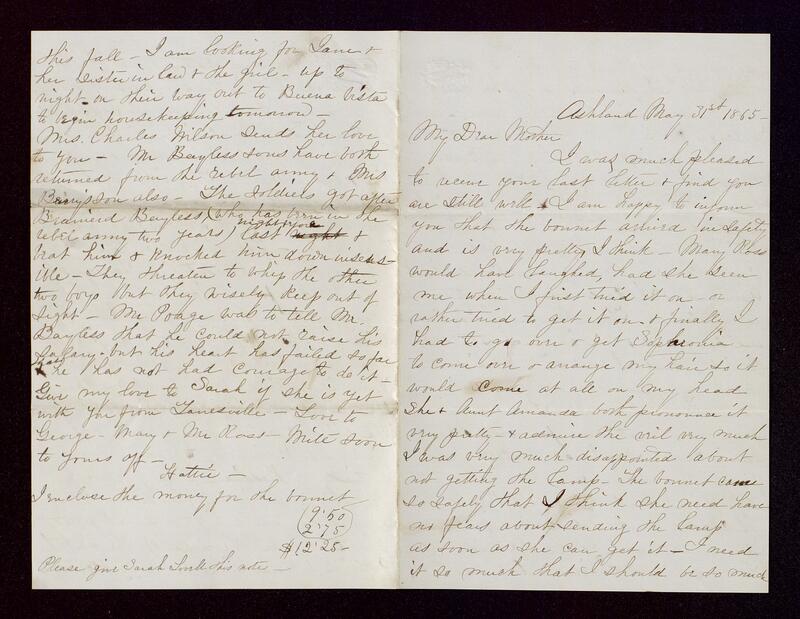 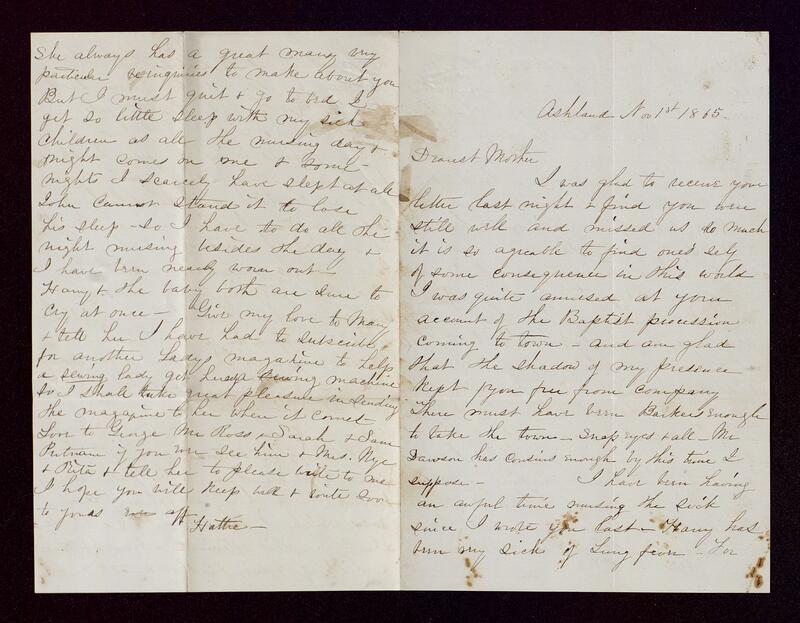 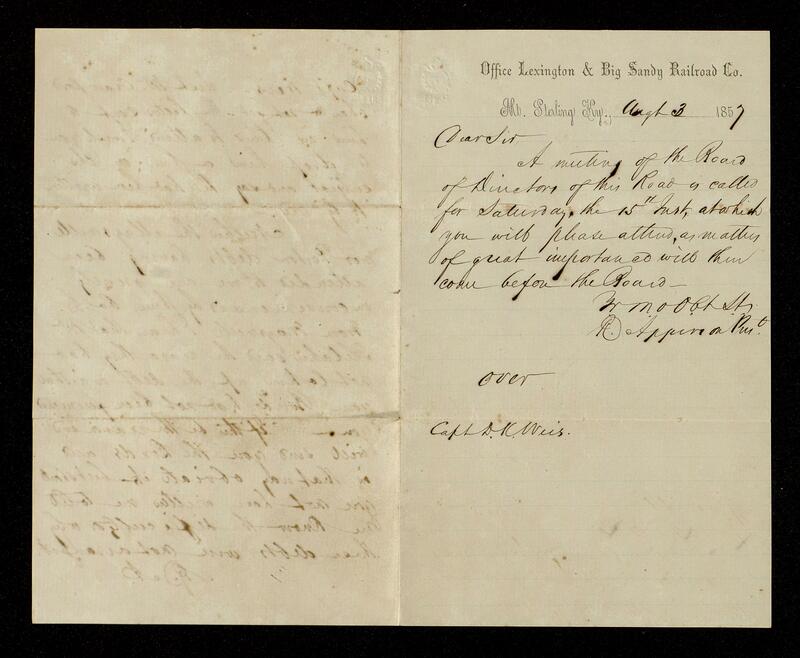 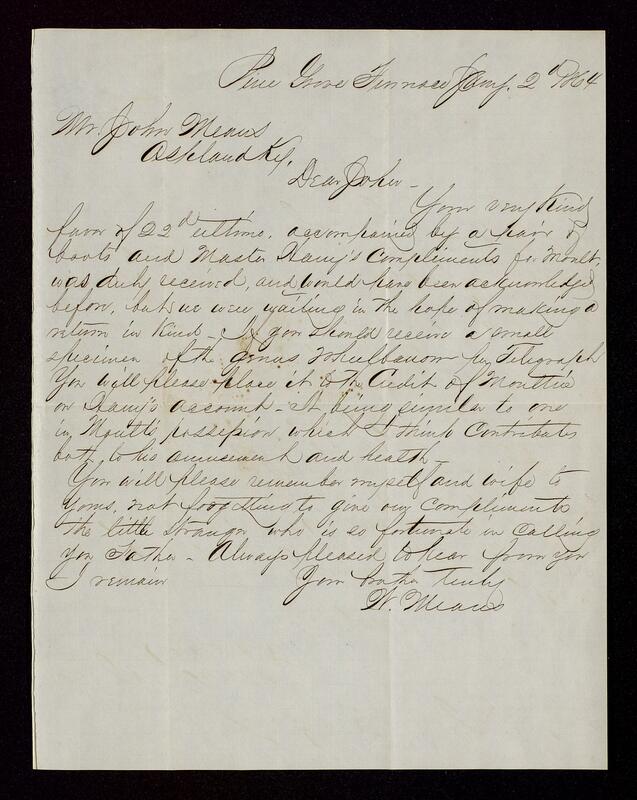 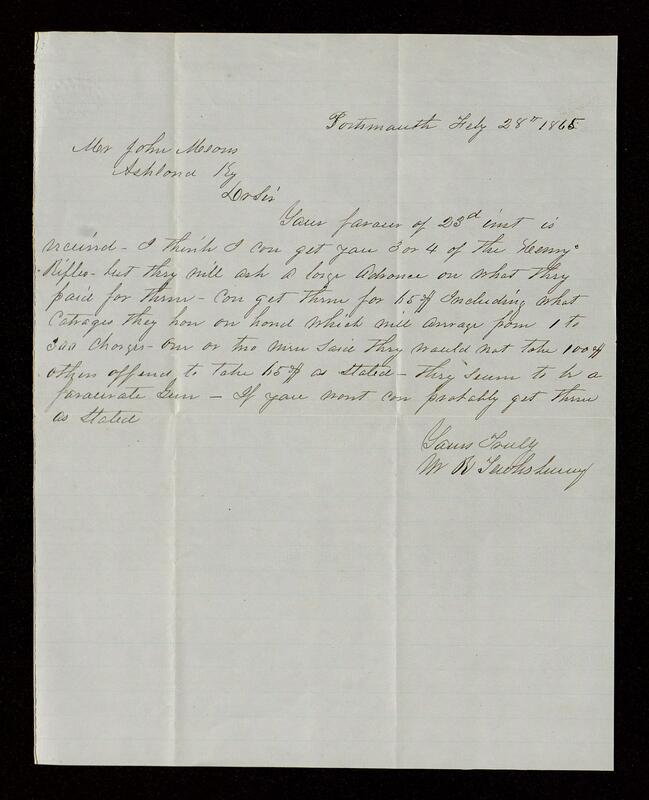 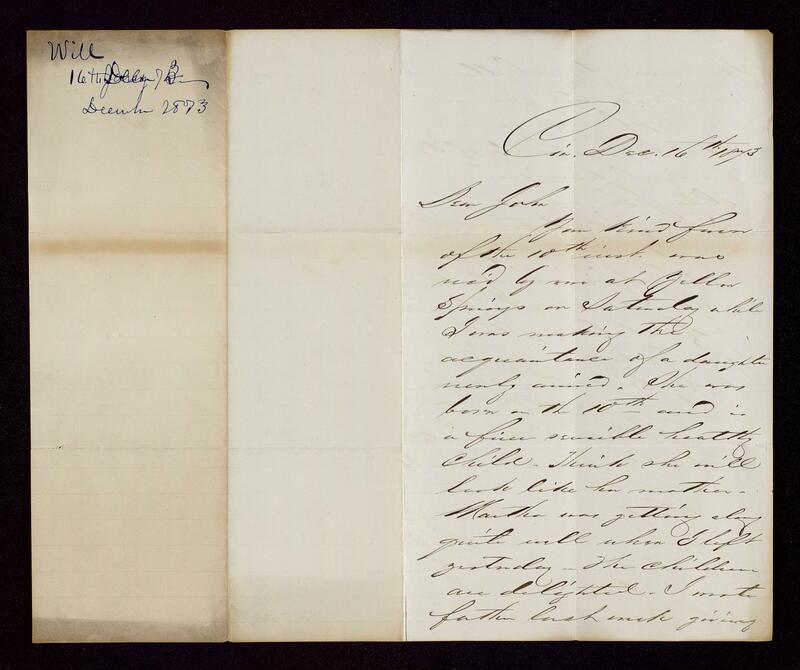 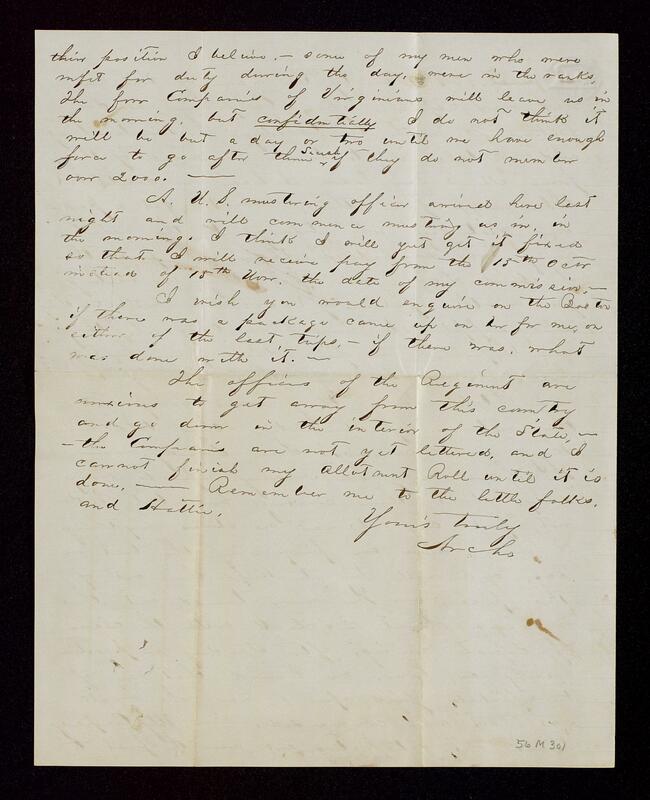 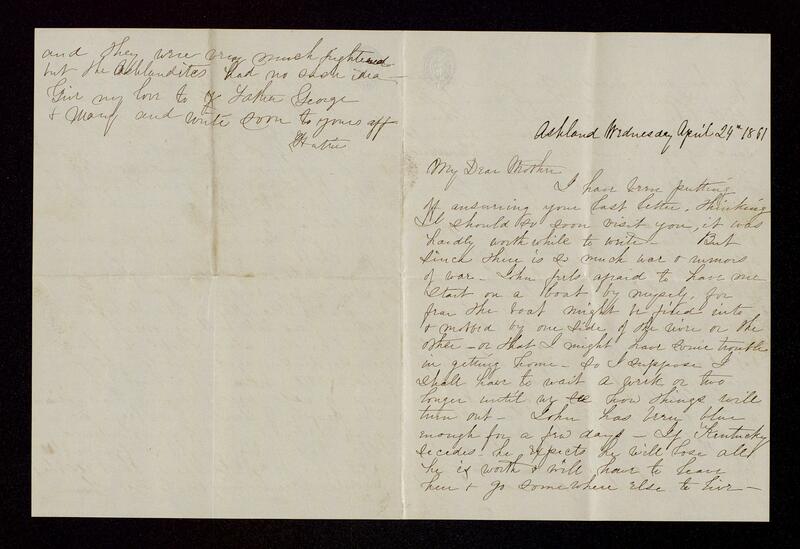 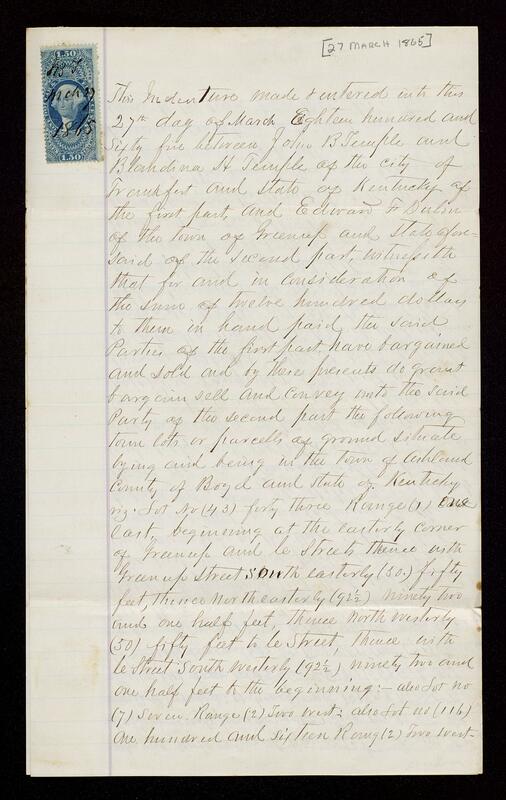 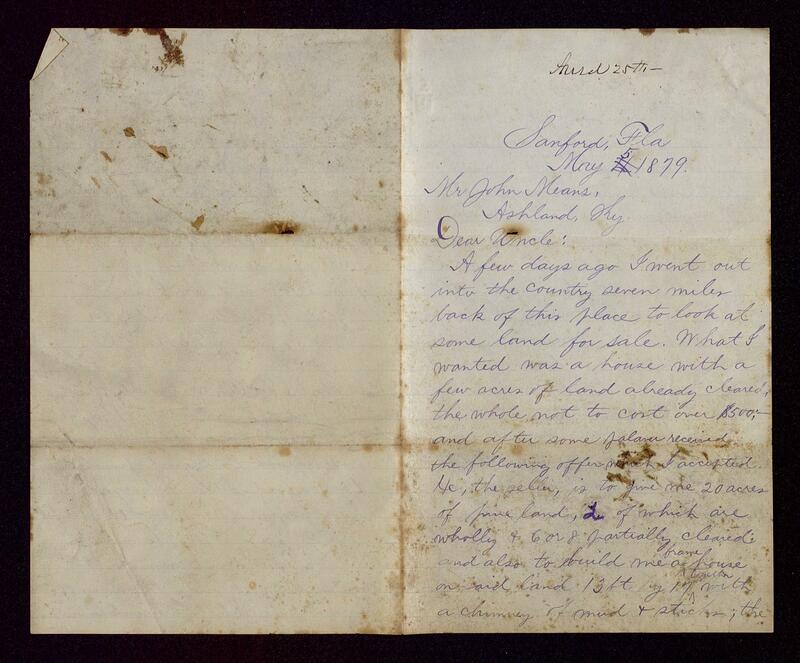 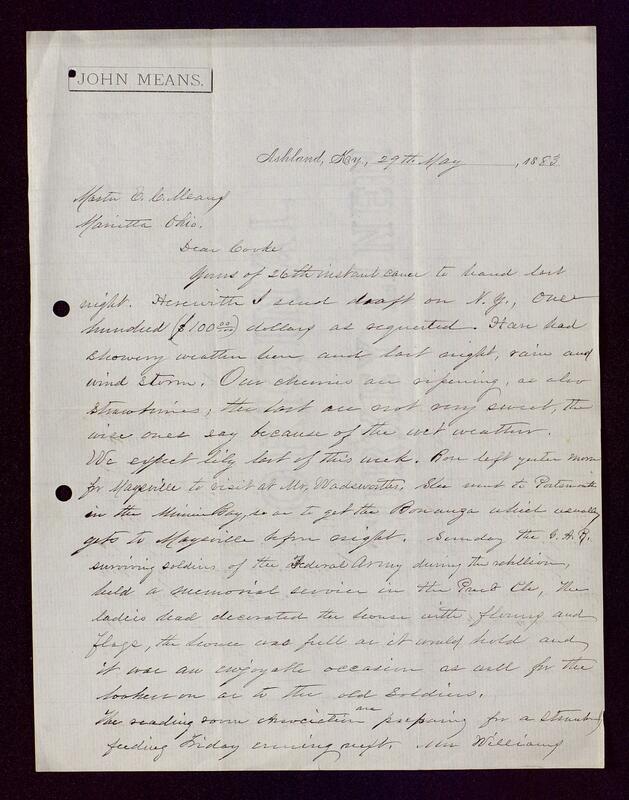 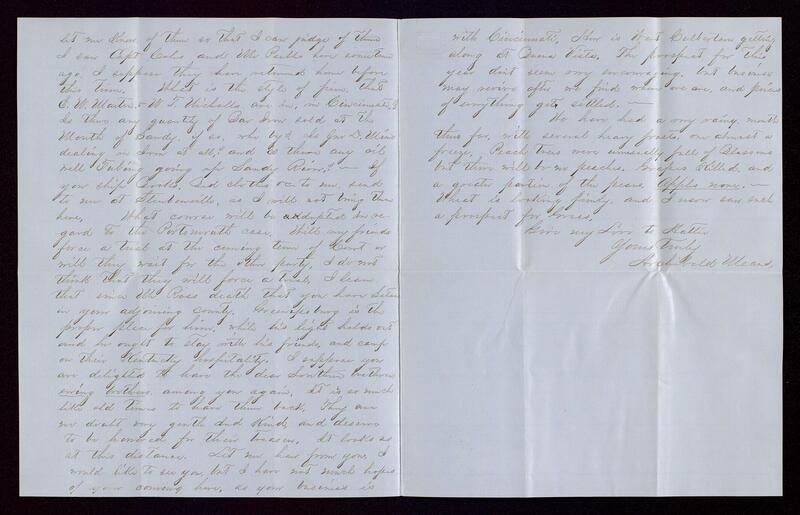 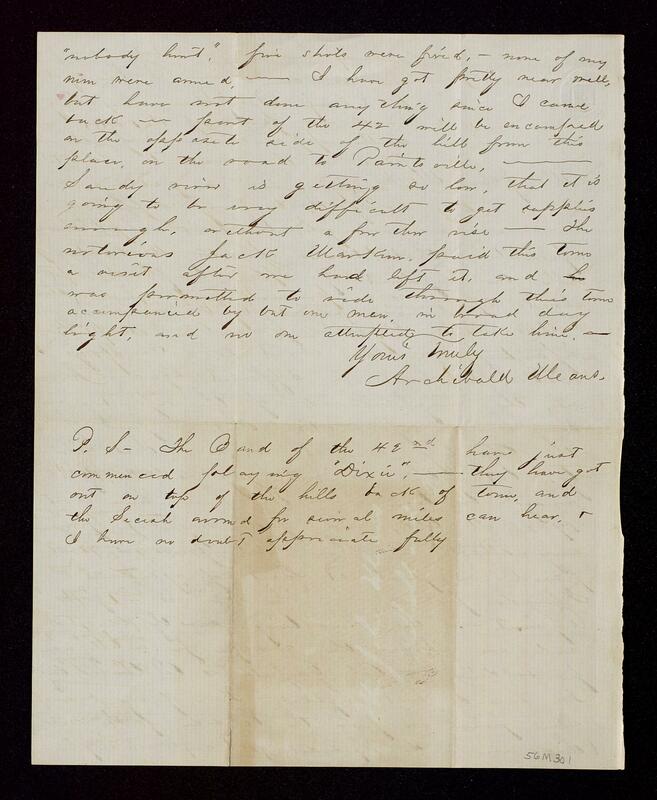 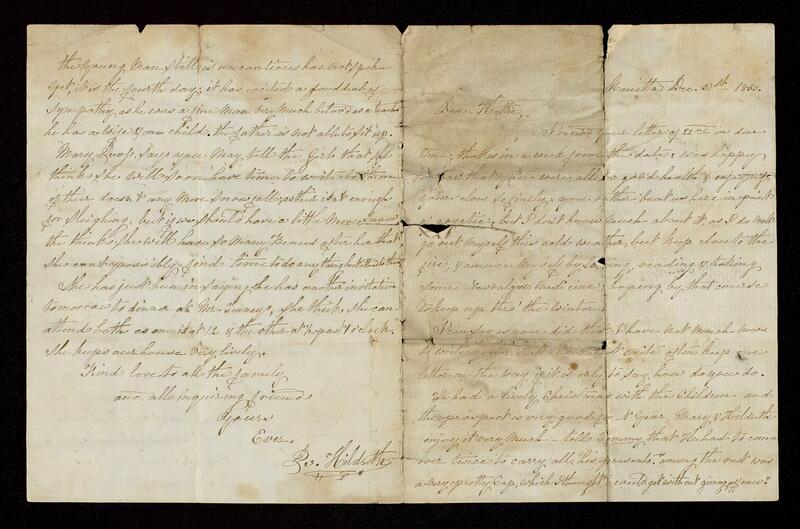 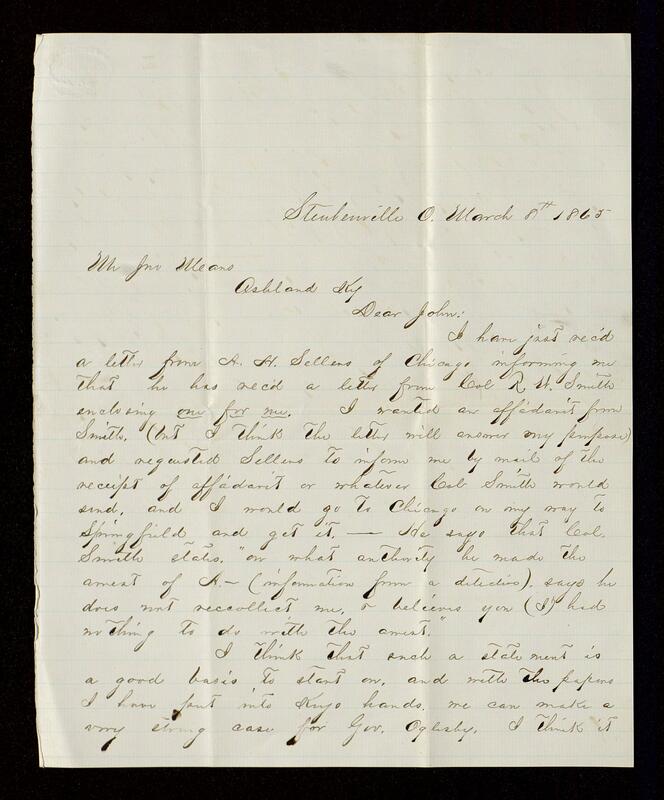 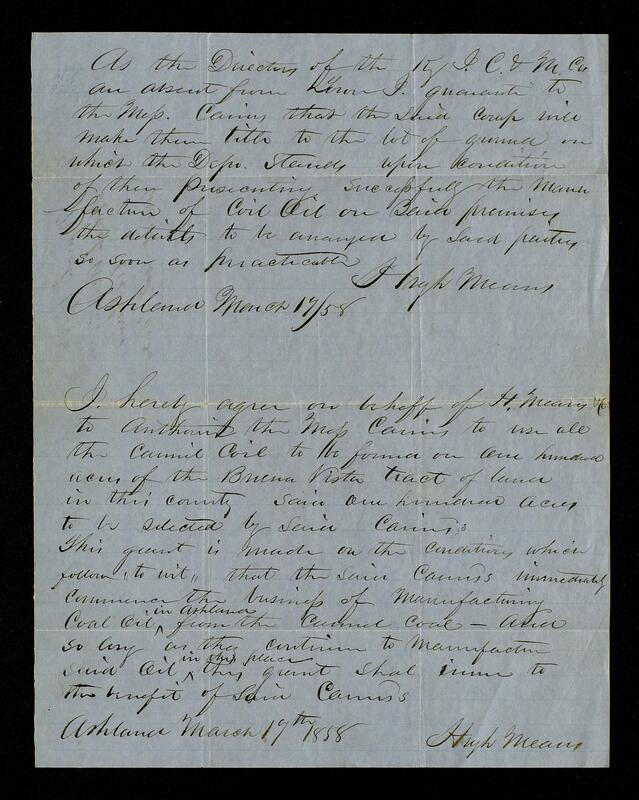 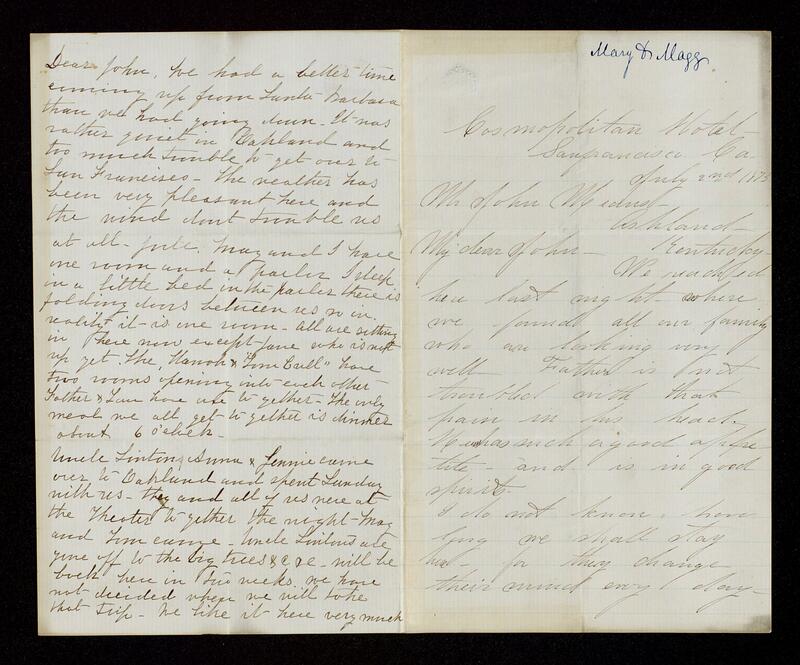 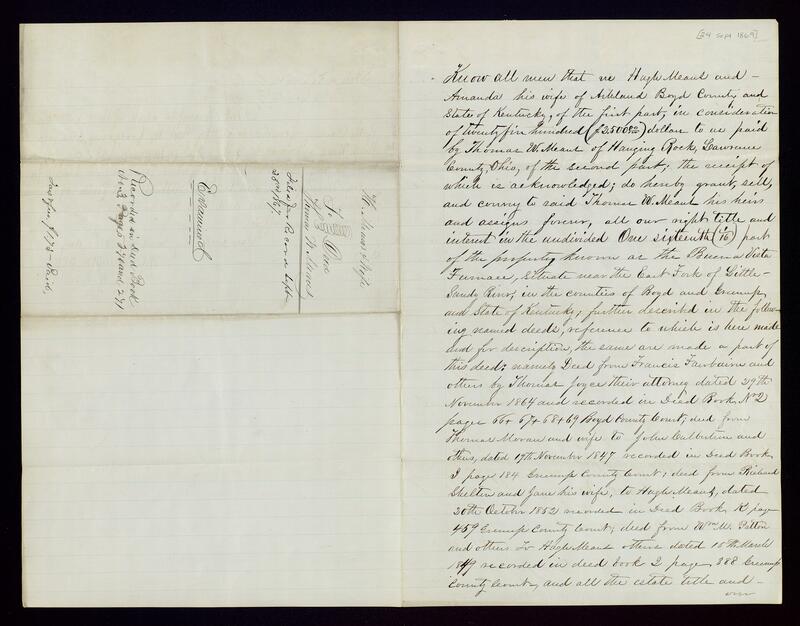 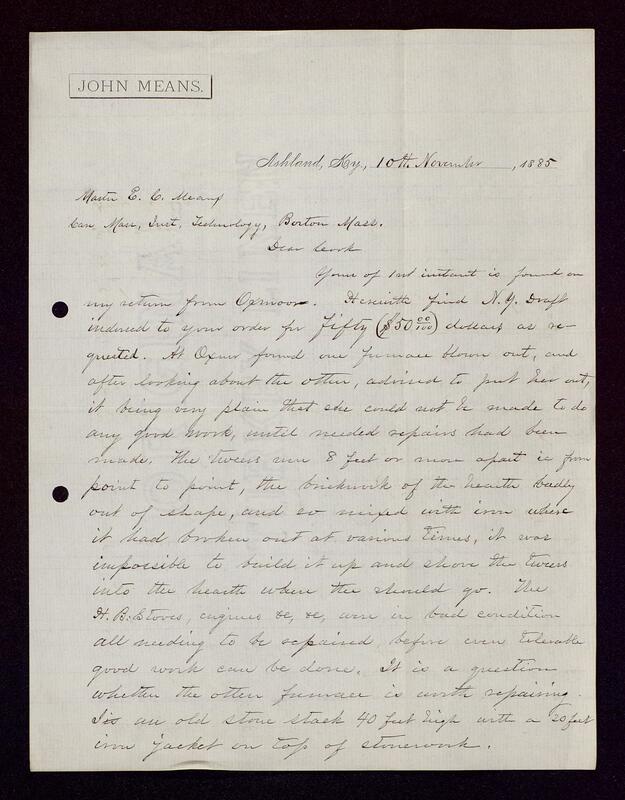 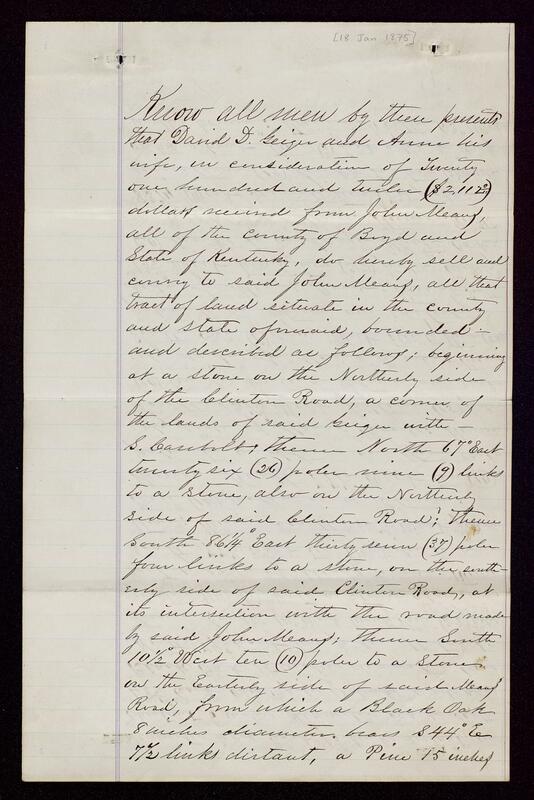 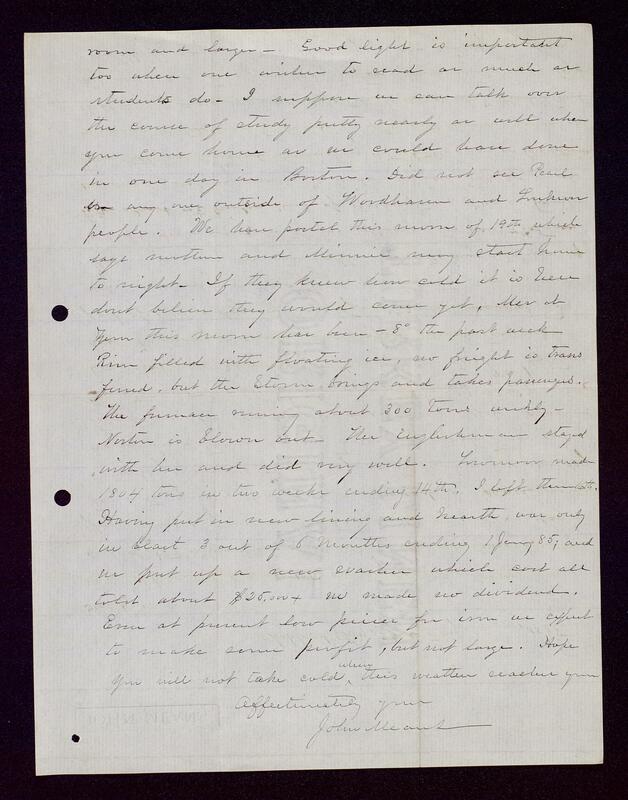 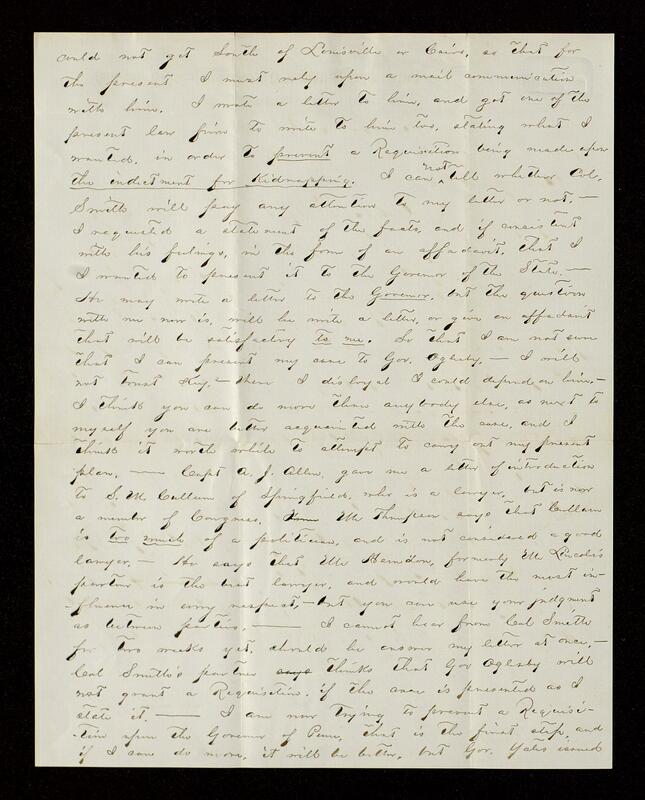 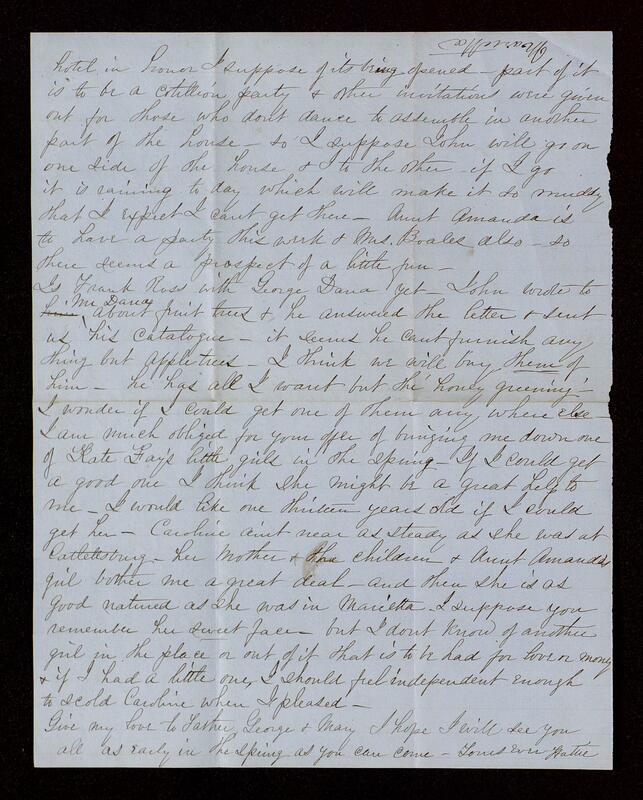 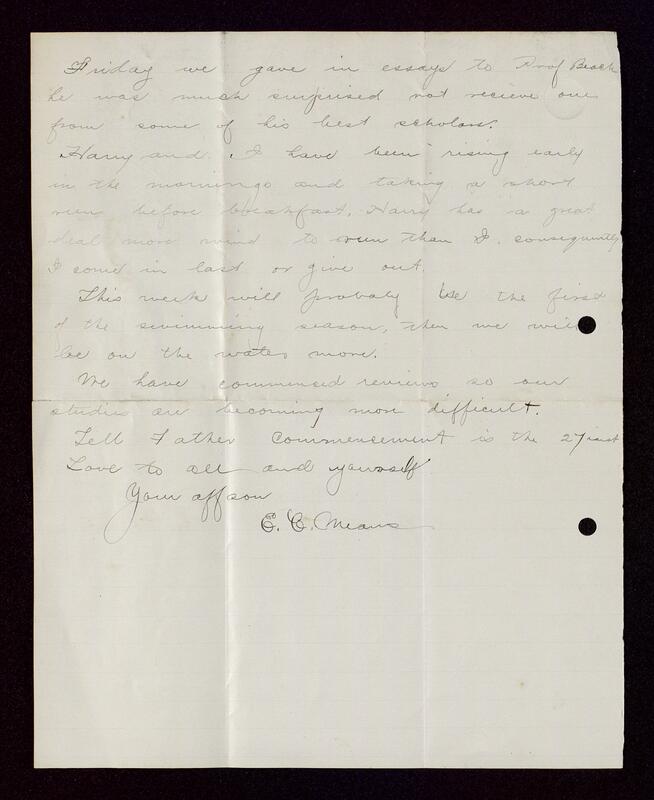 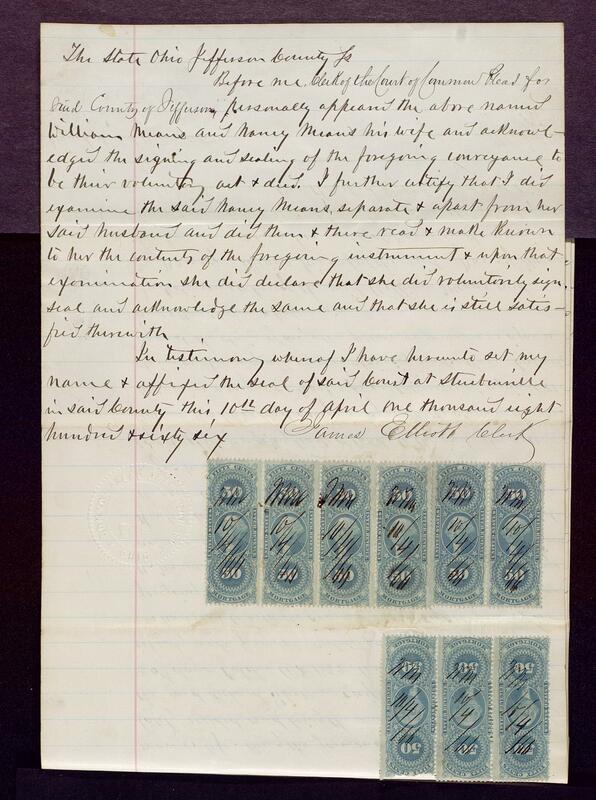 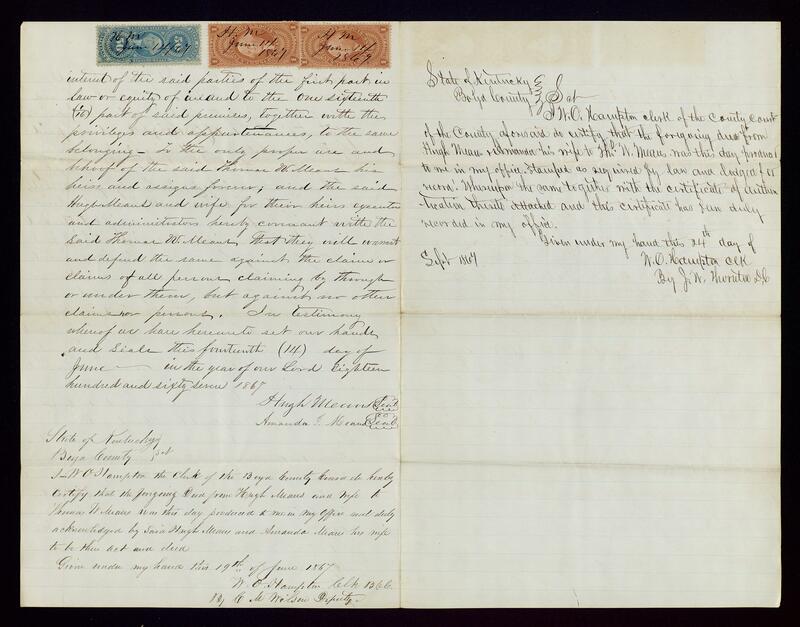 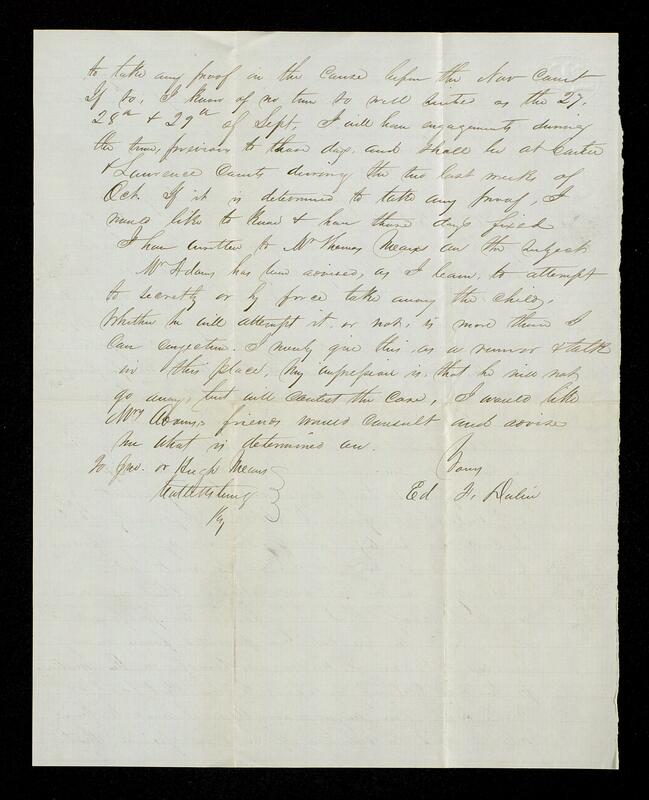 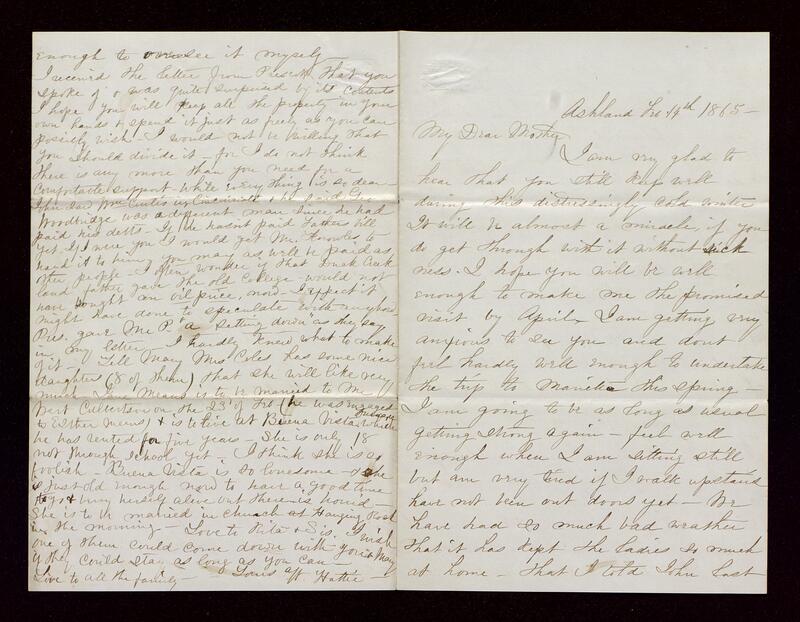 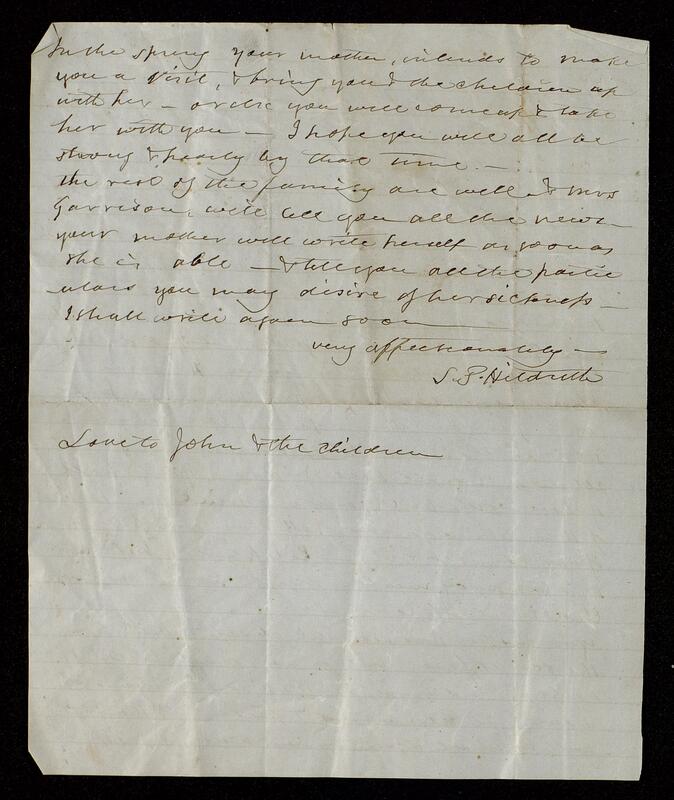 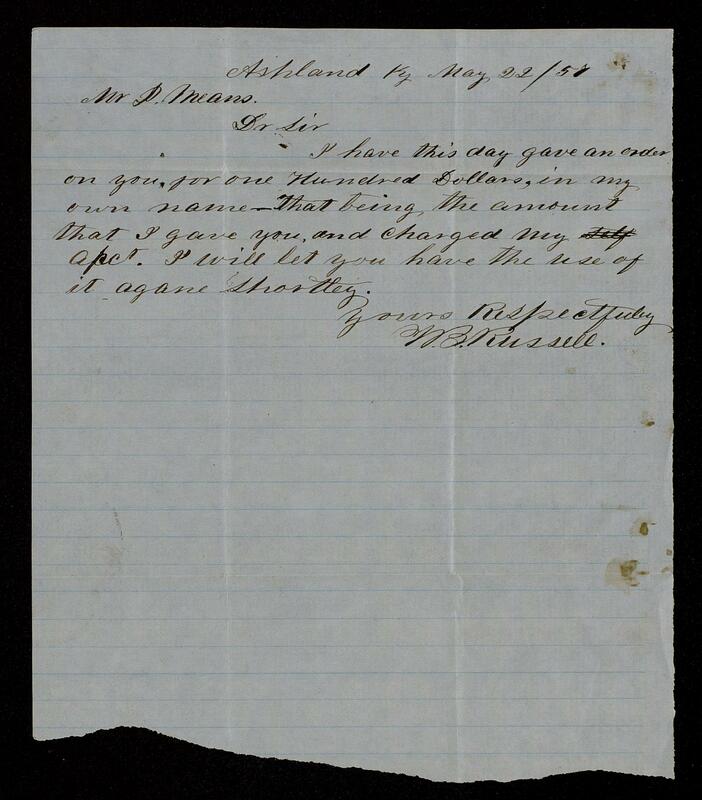 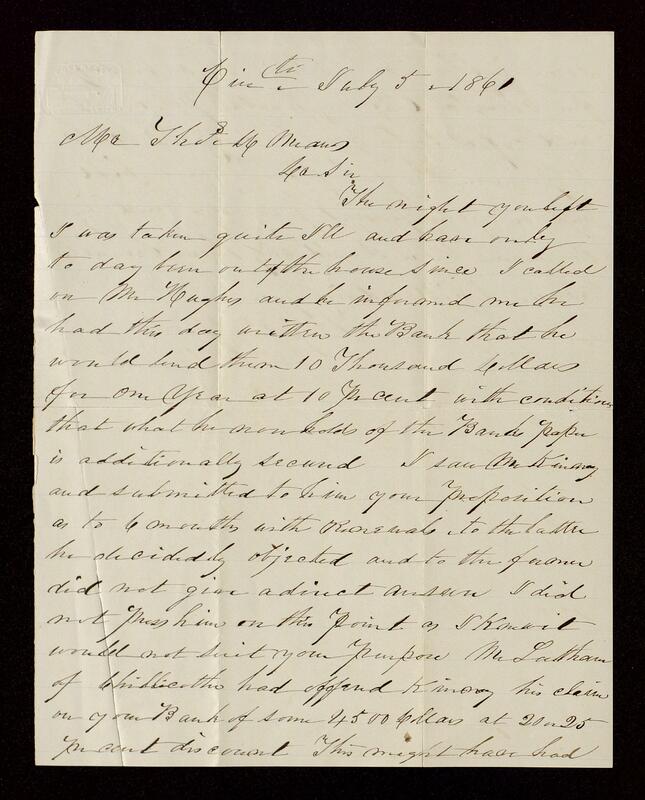 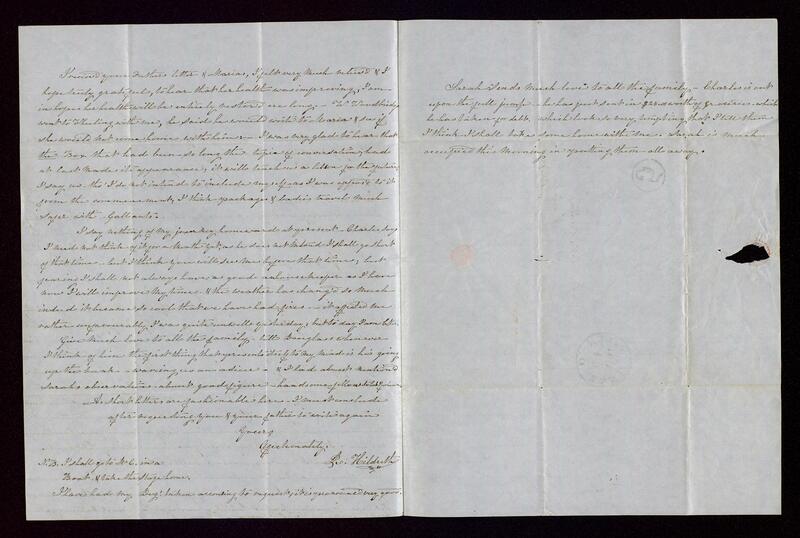 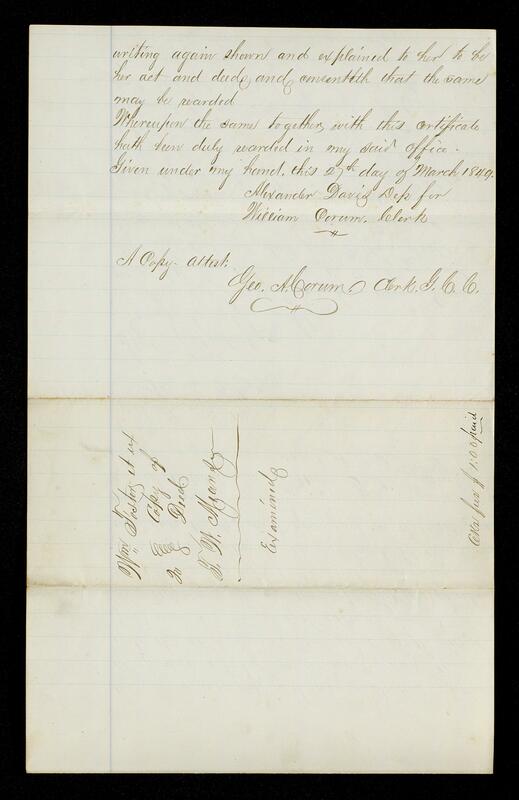 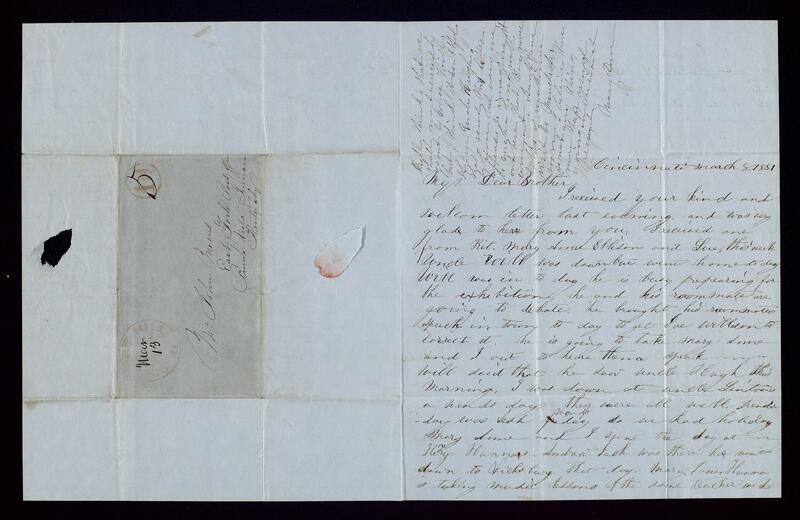 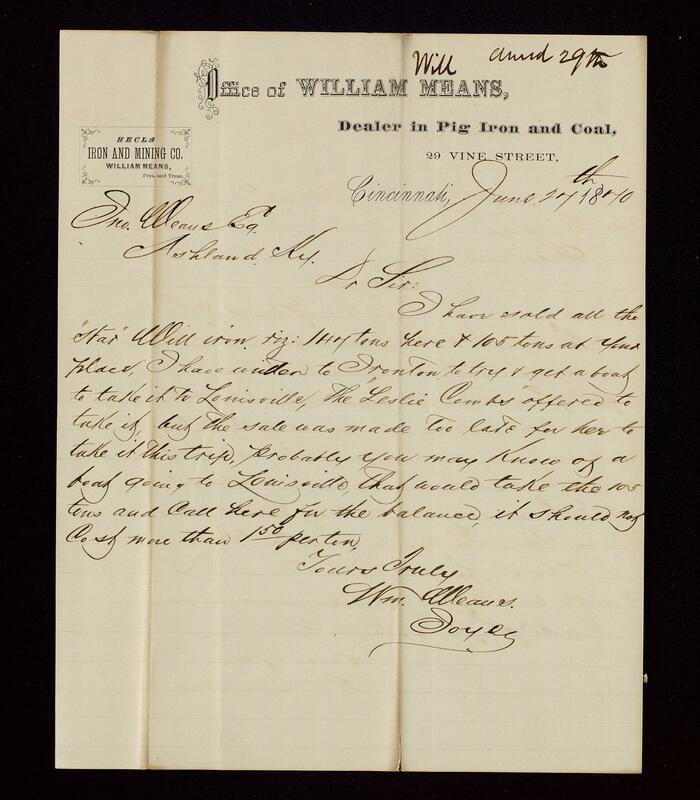 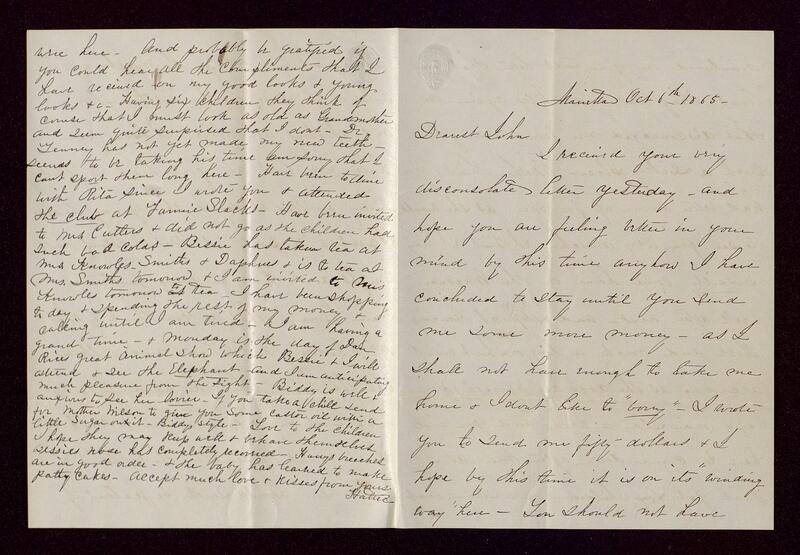 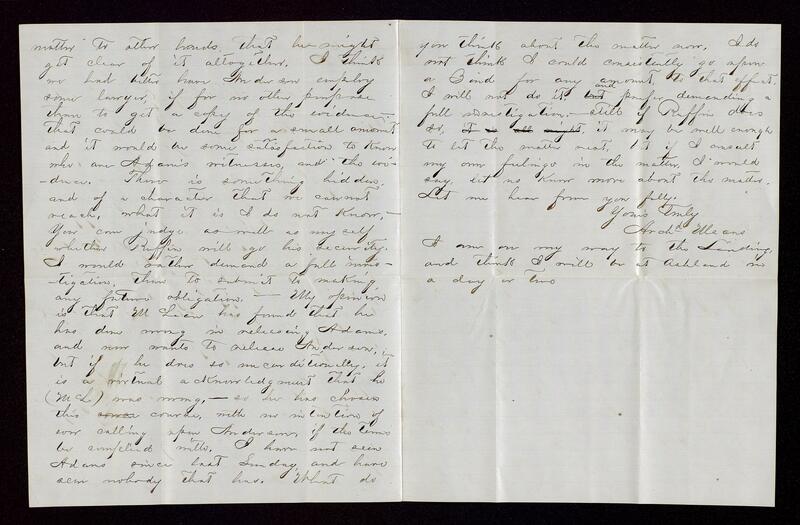 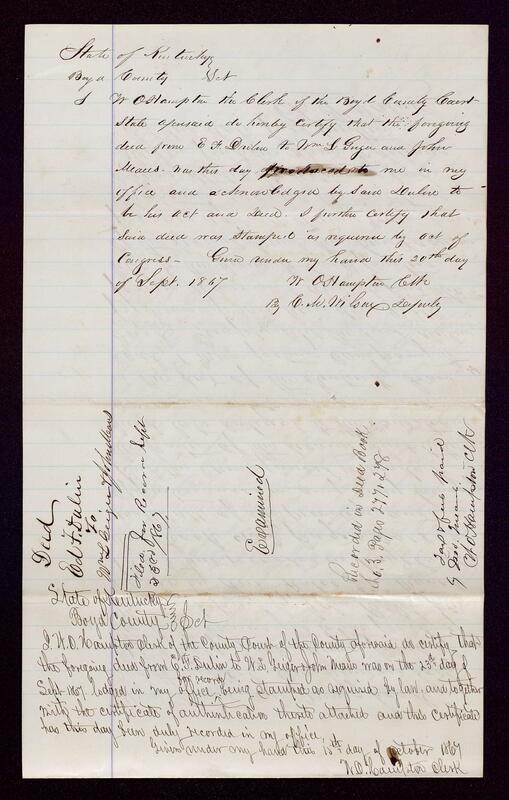 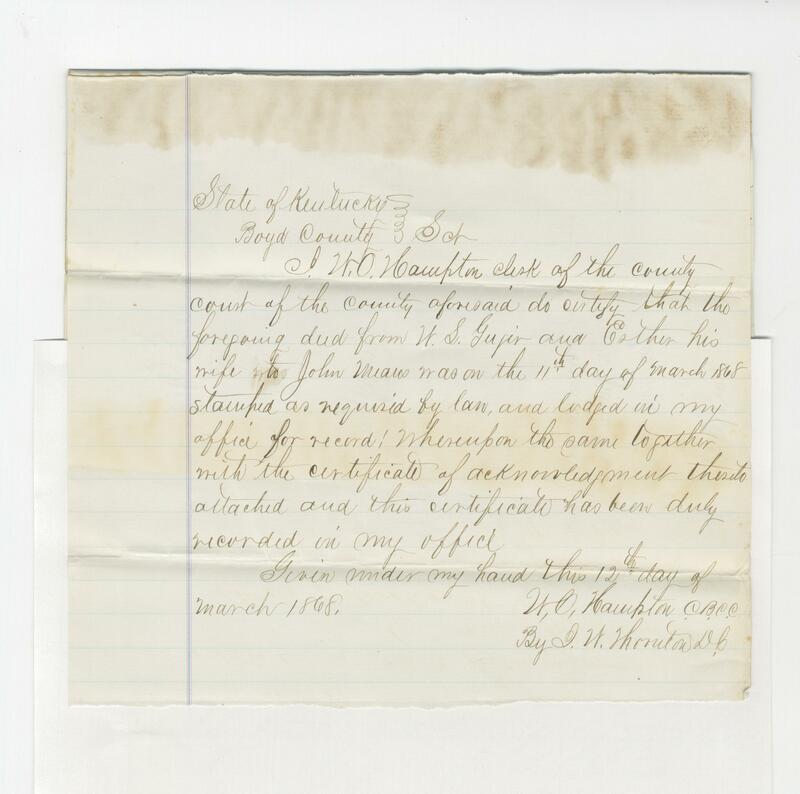 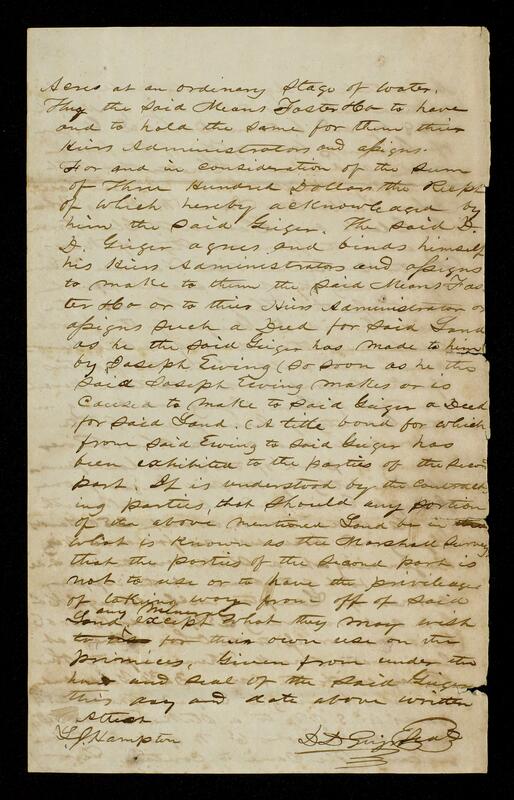 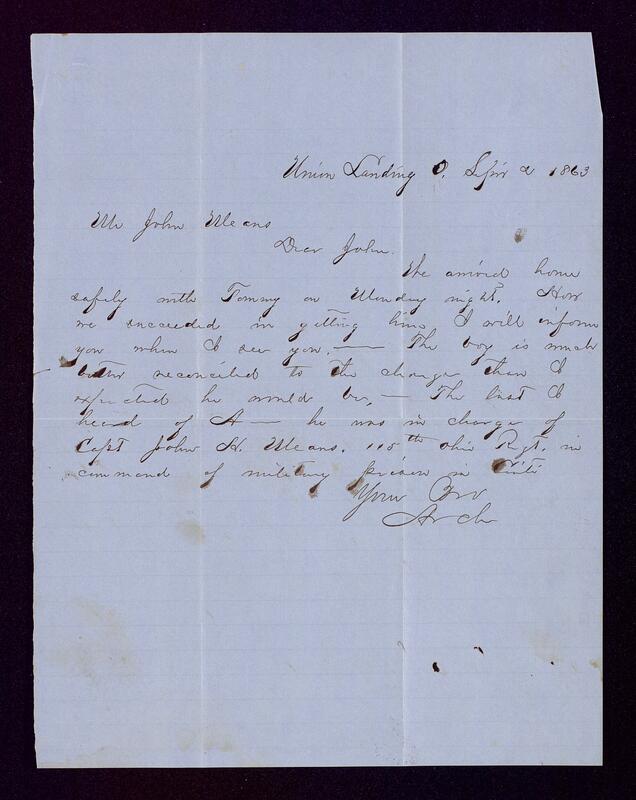 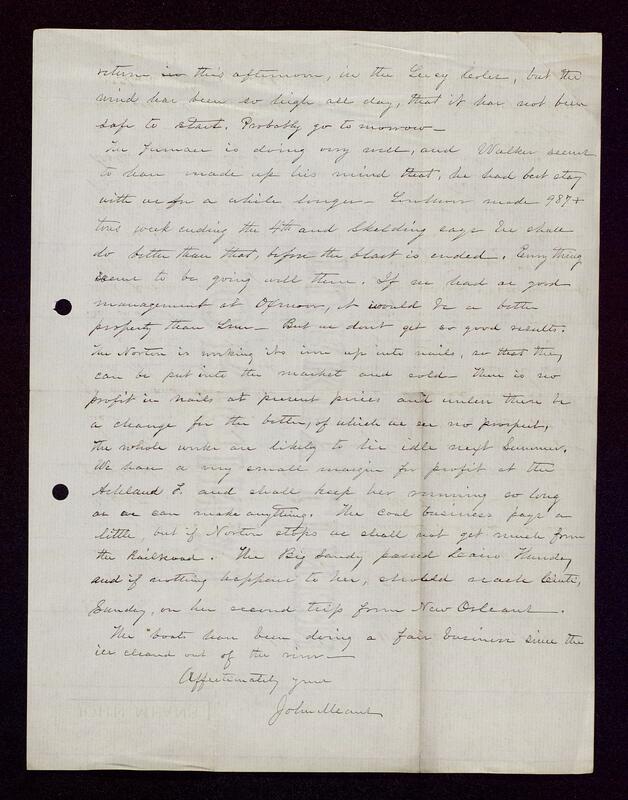 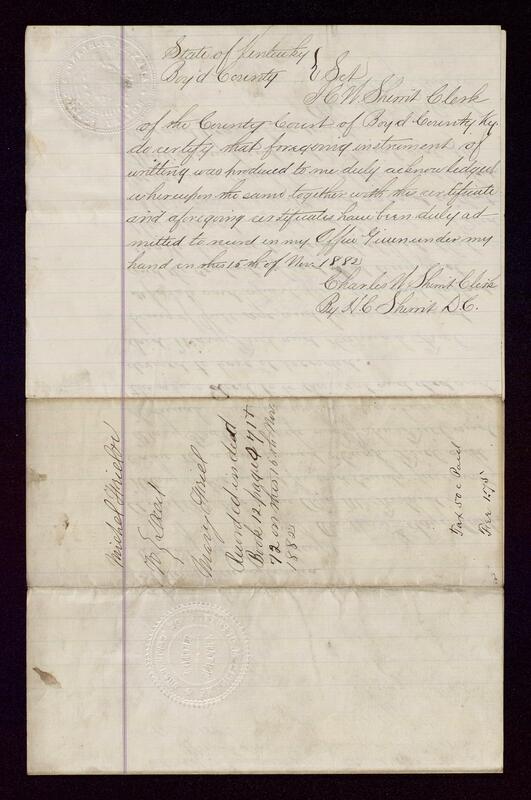 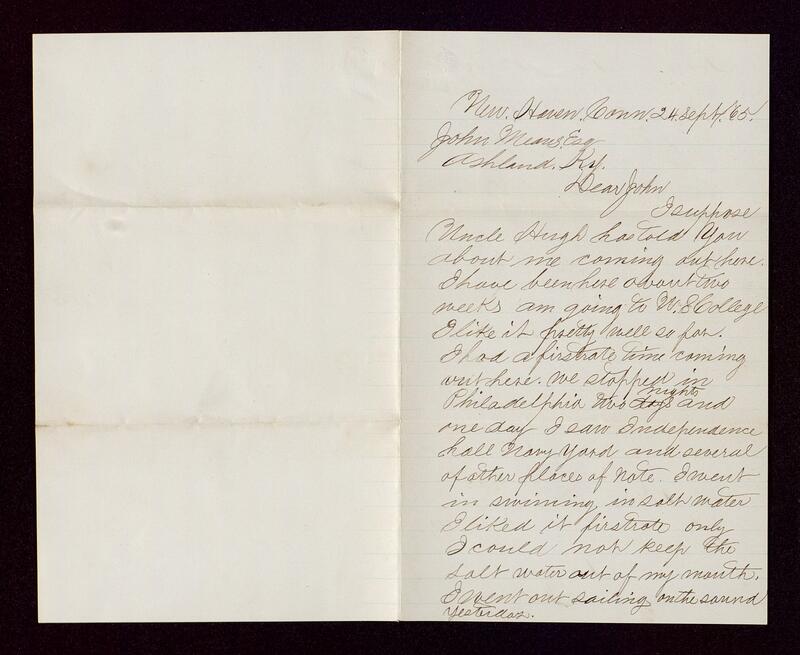 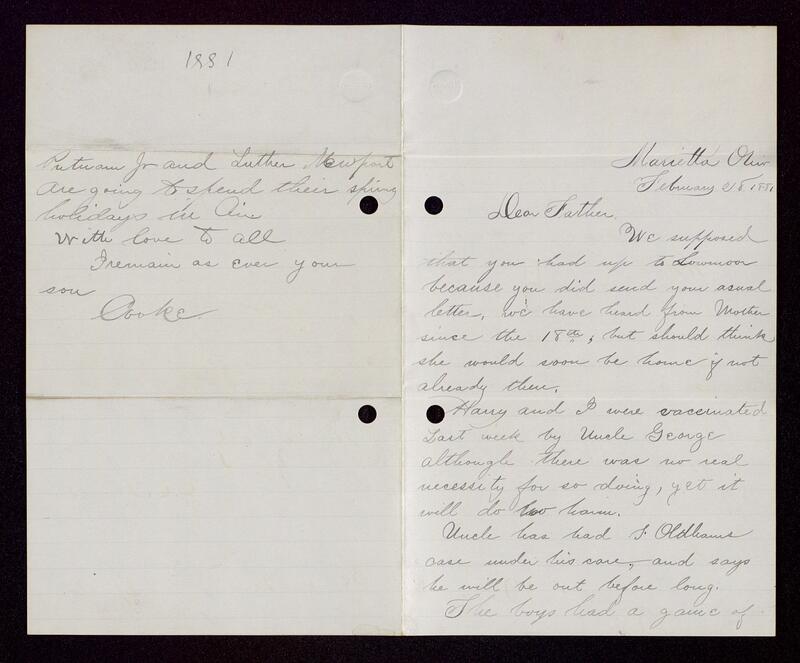 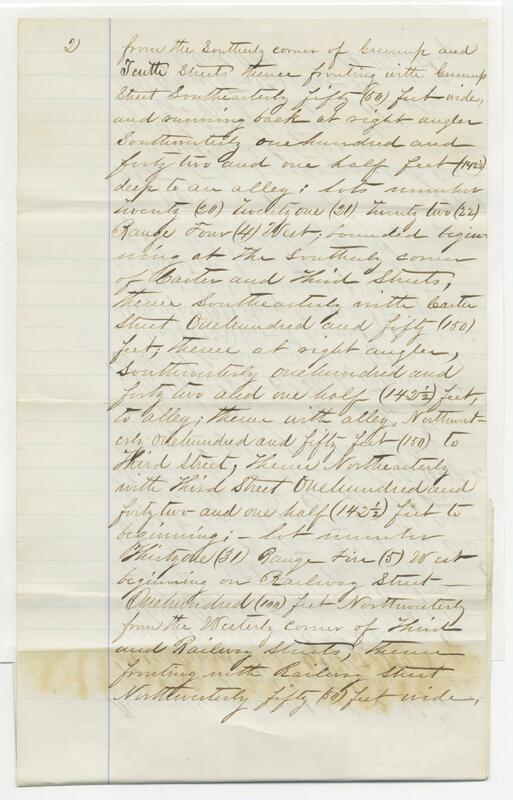 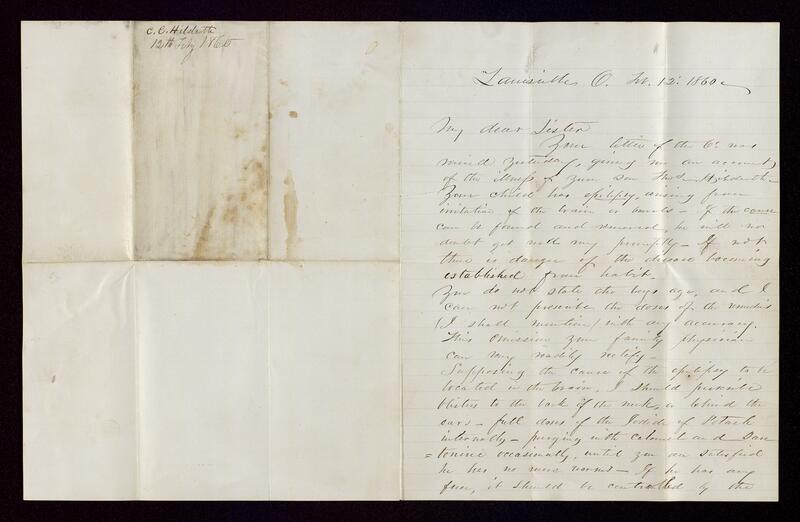 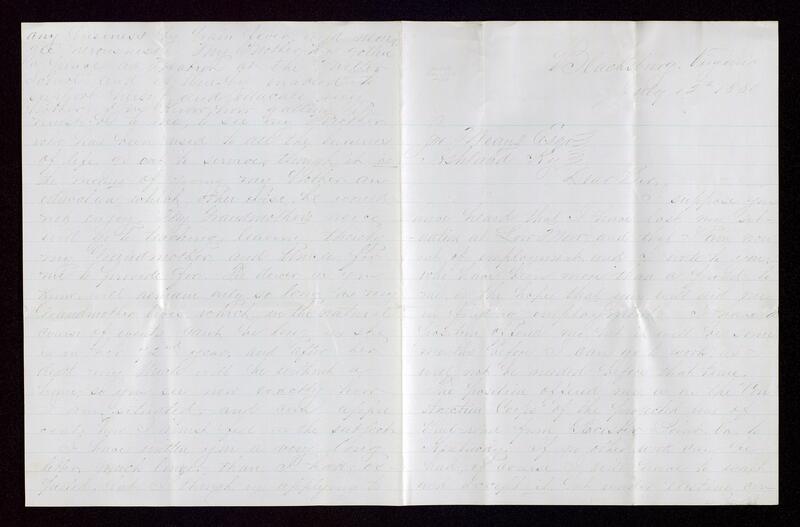 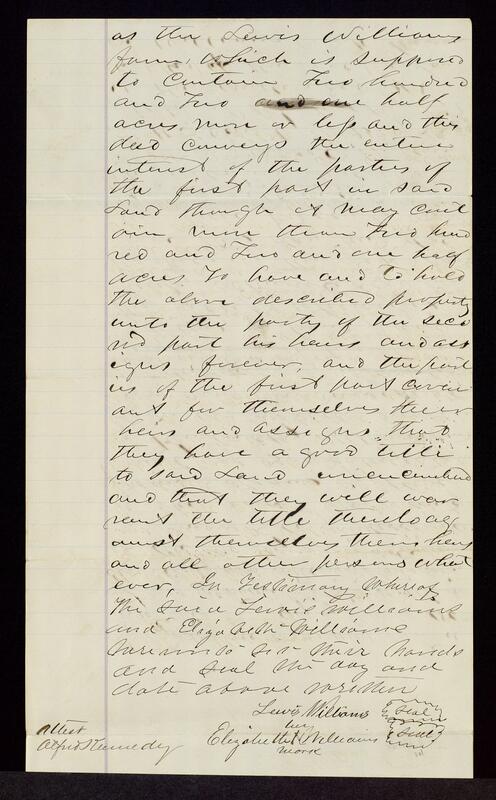 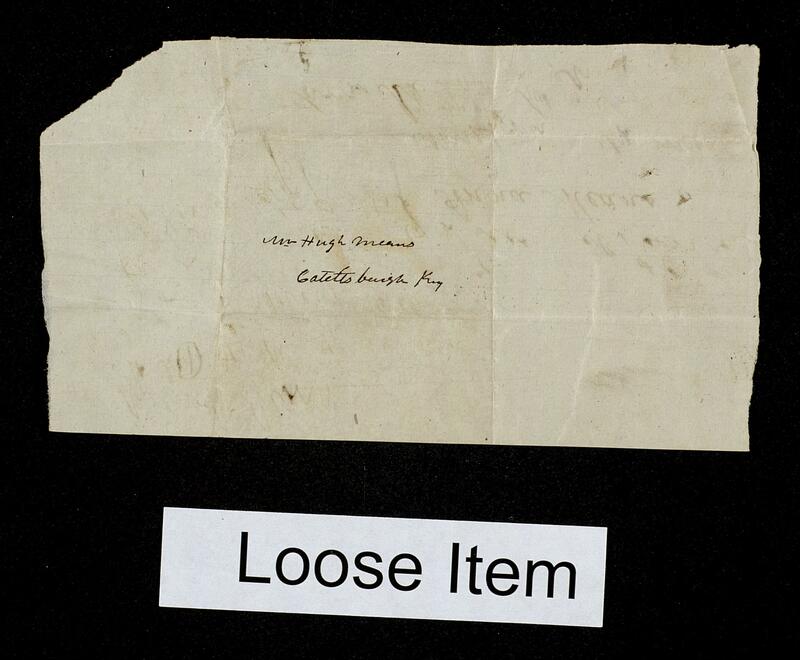 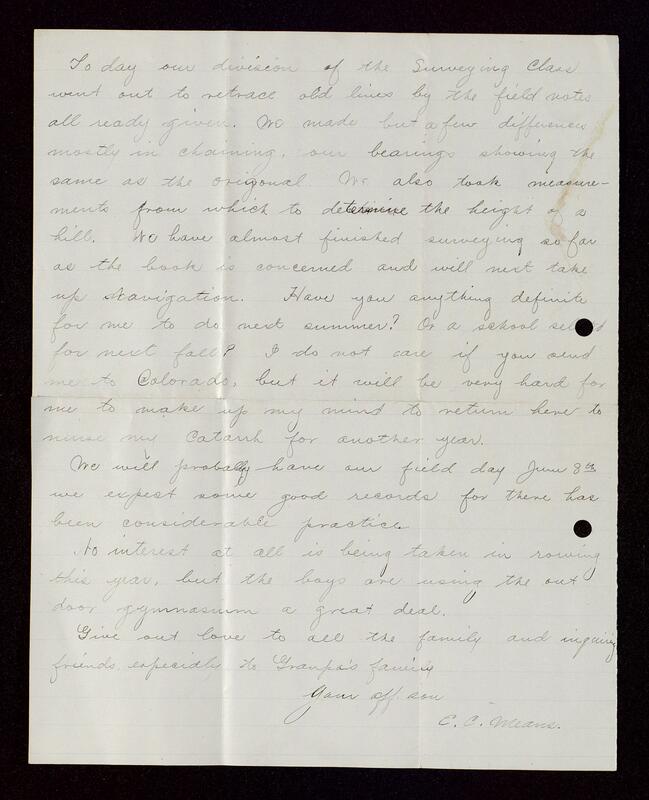 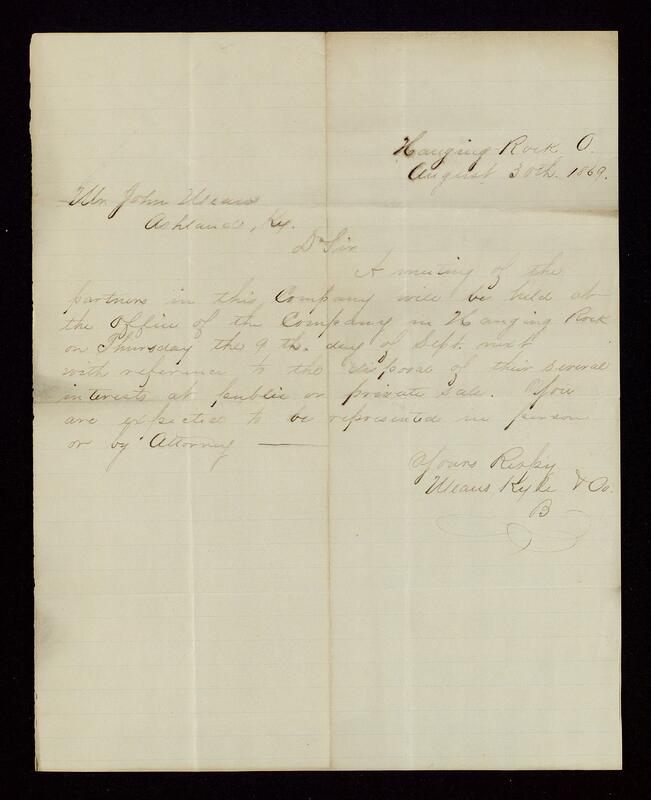 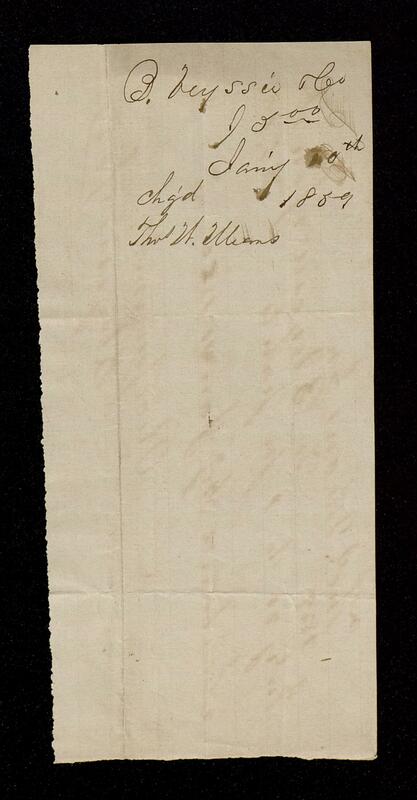 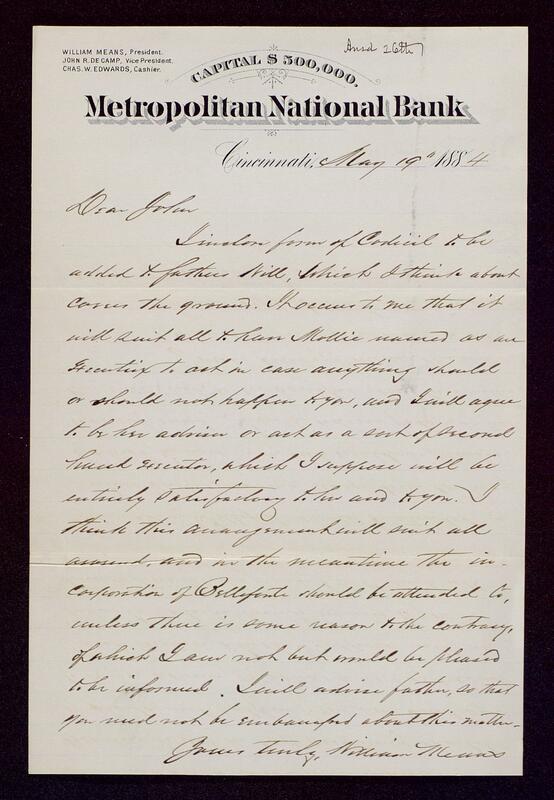 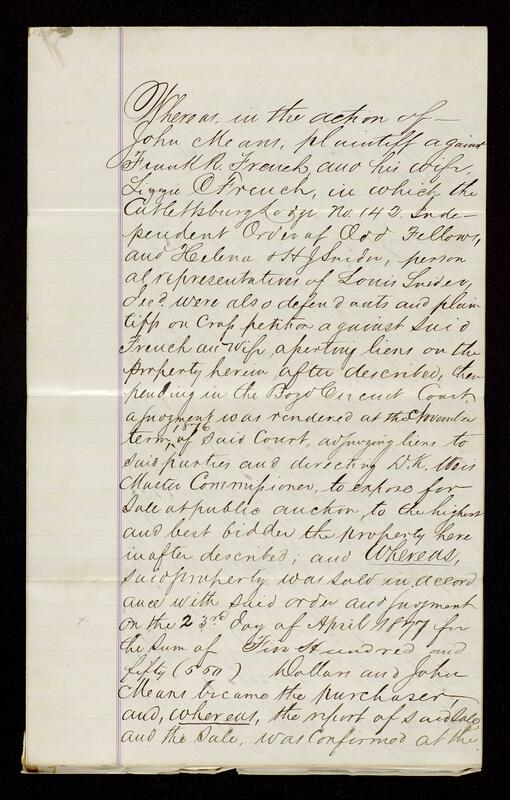 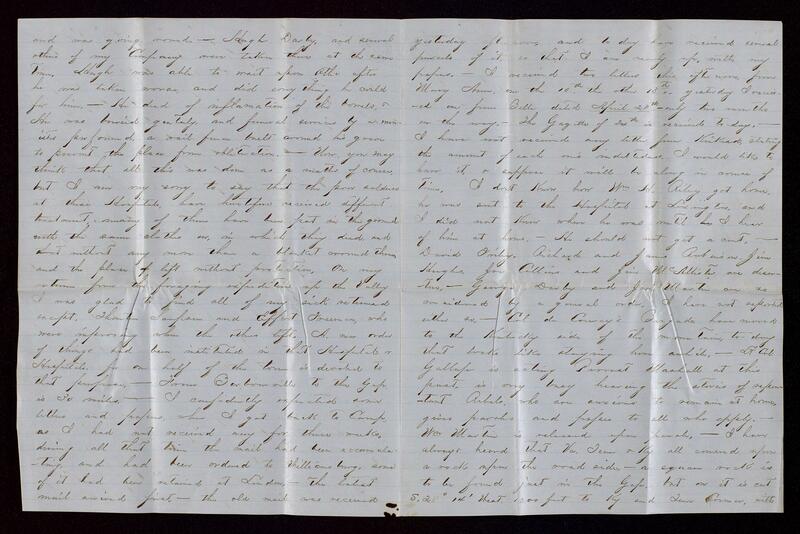 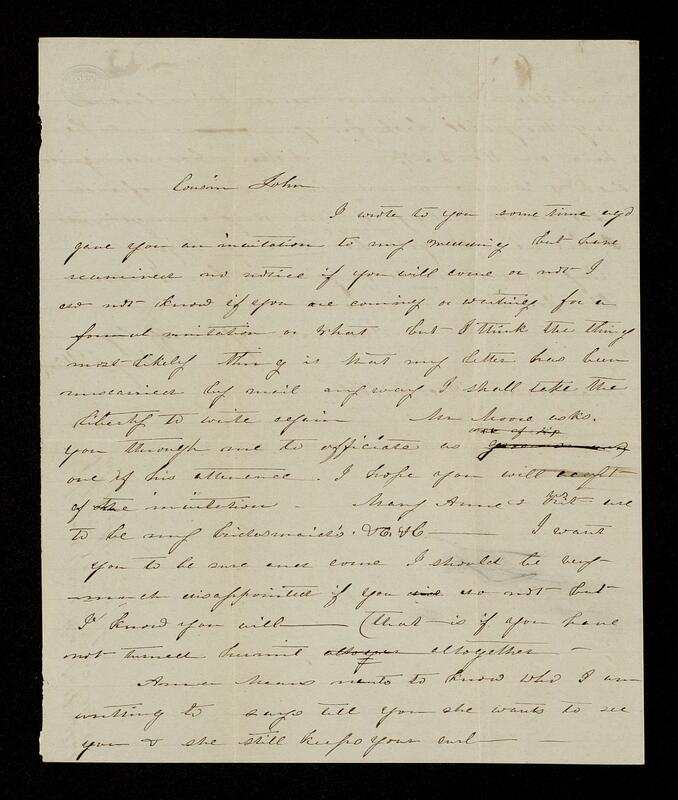 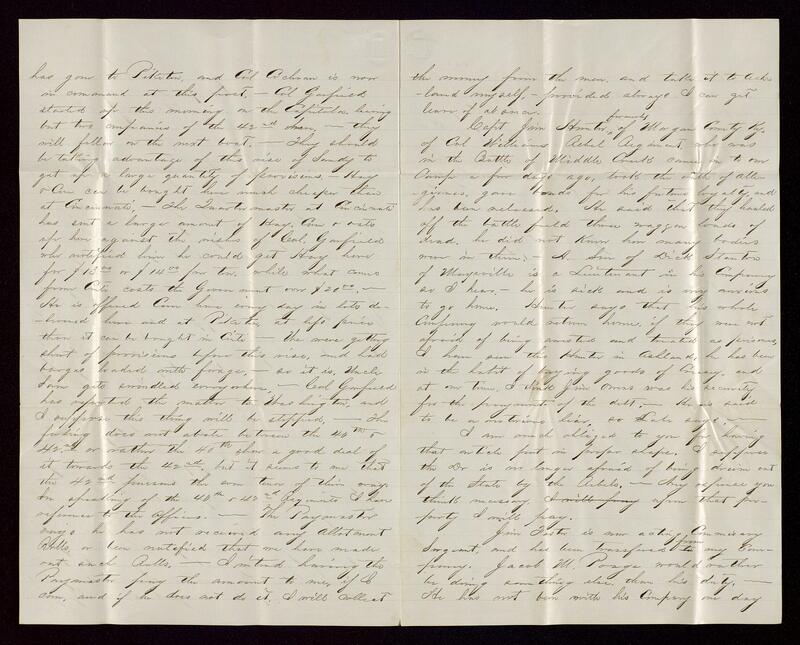 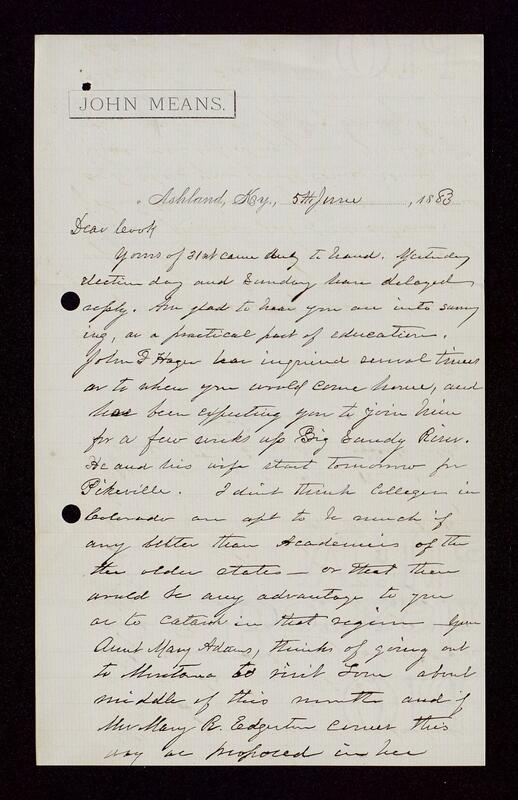 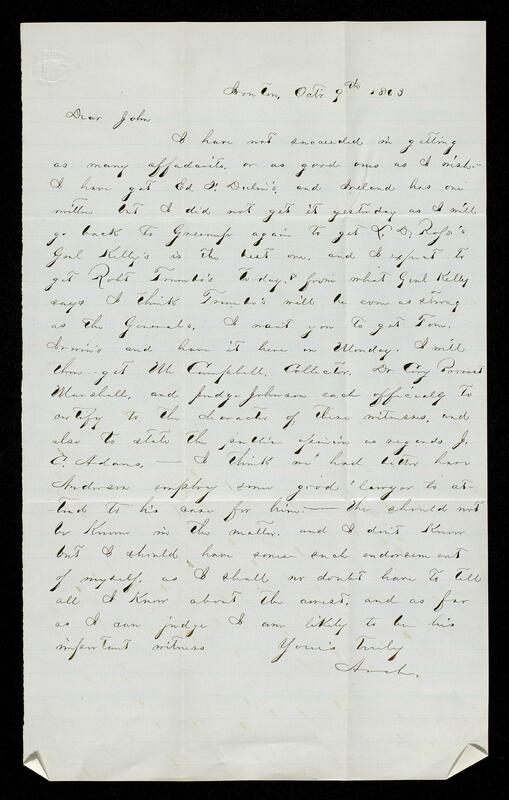 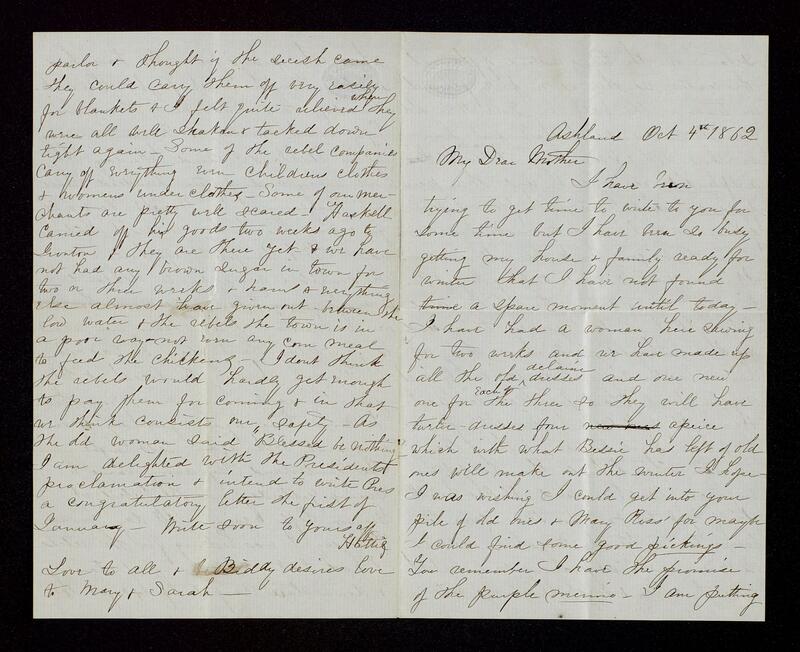 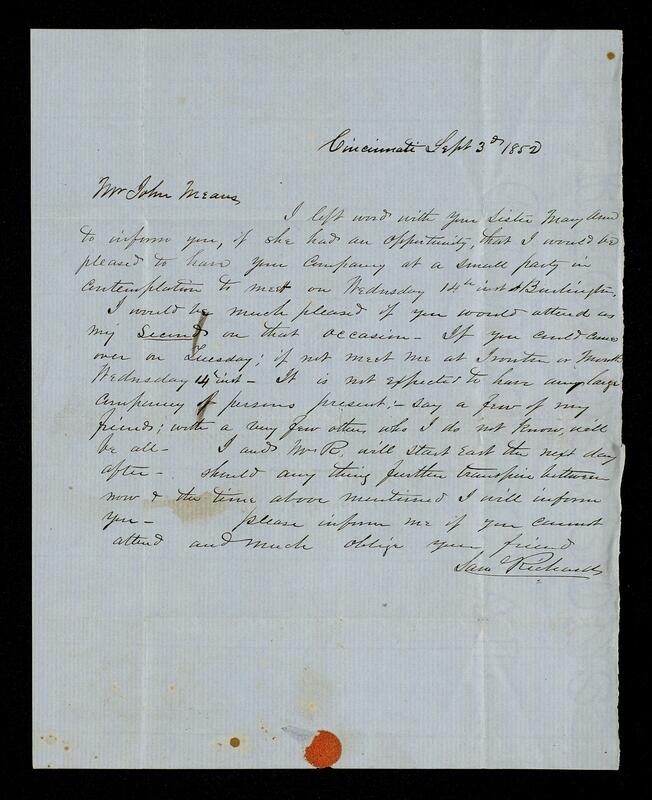 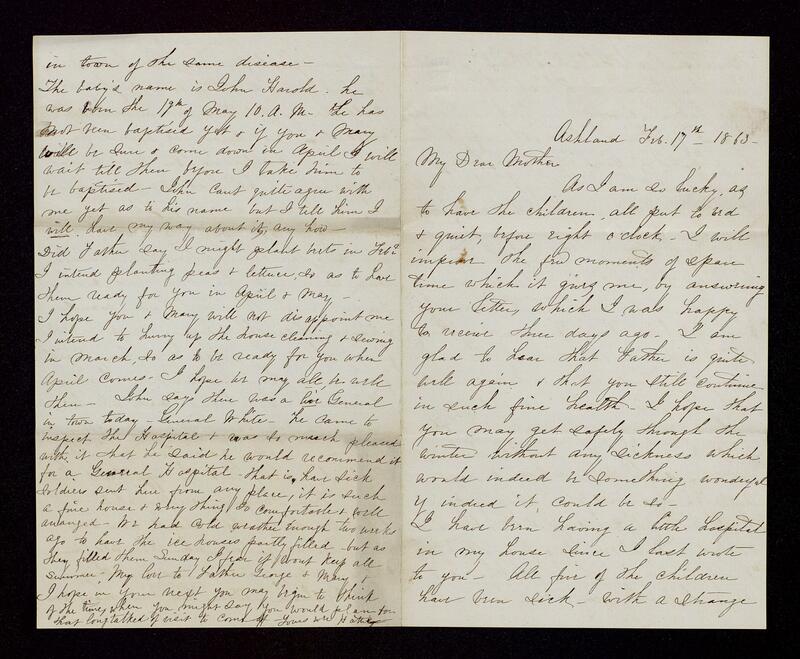 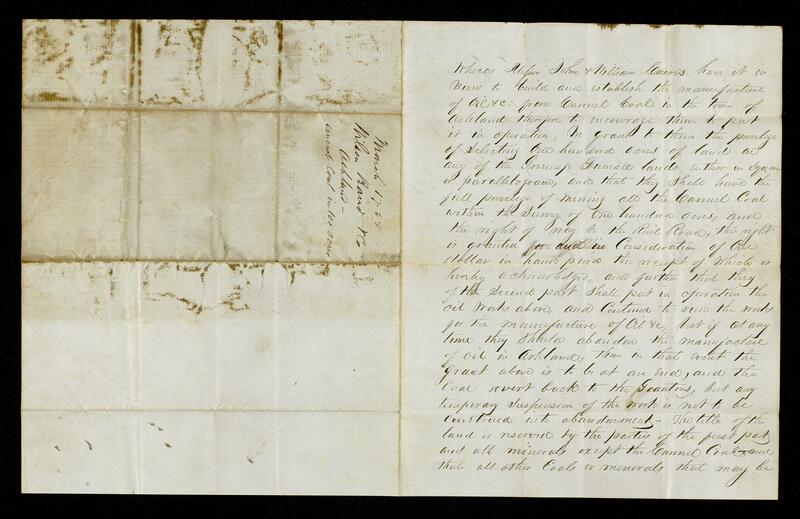 Papers from the Civil War period include several letters from Archibald Means, an officer in the Union forces of eastern Kentucky. 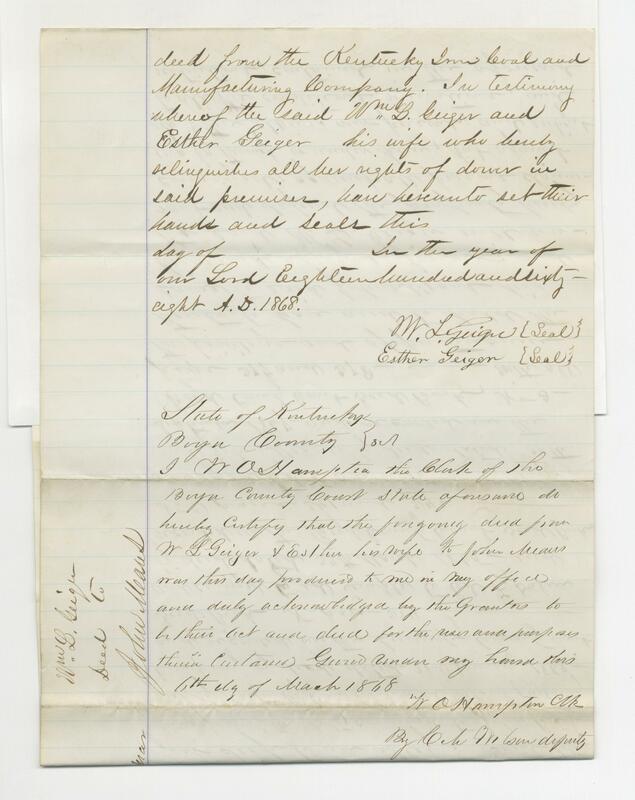 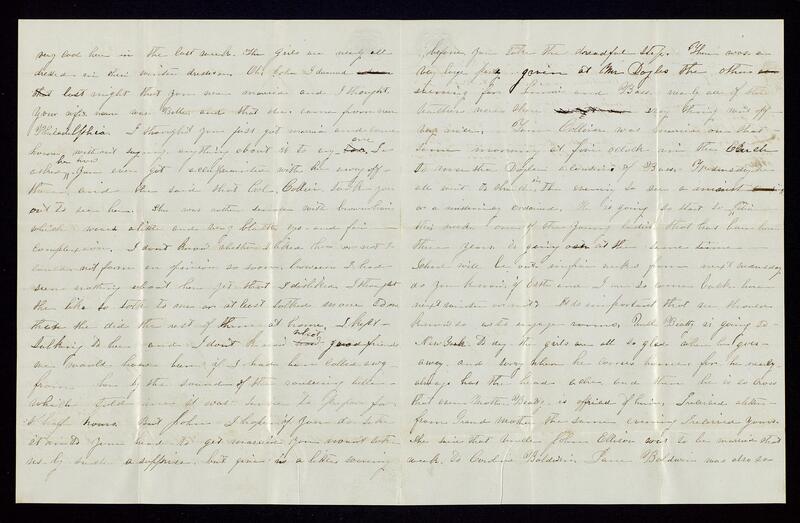 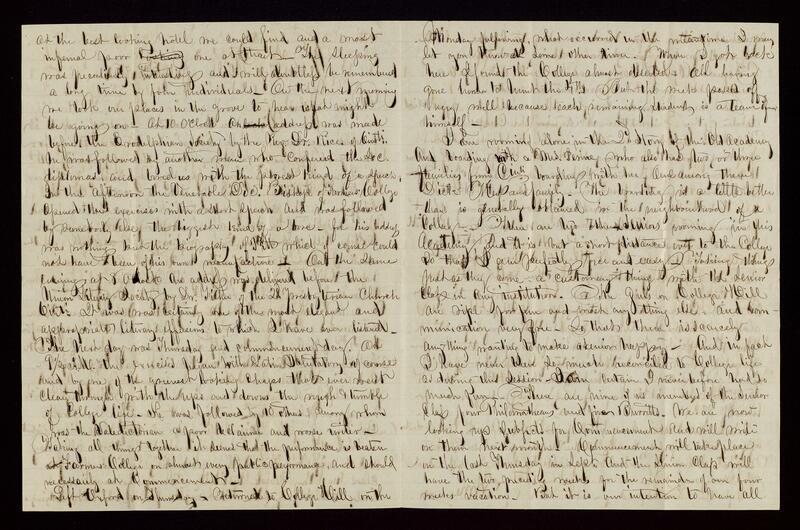 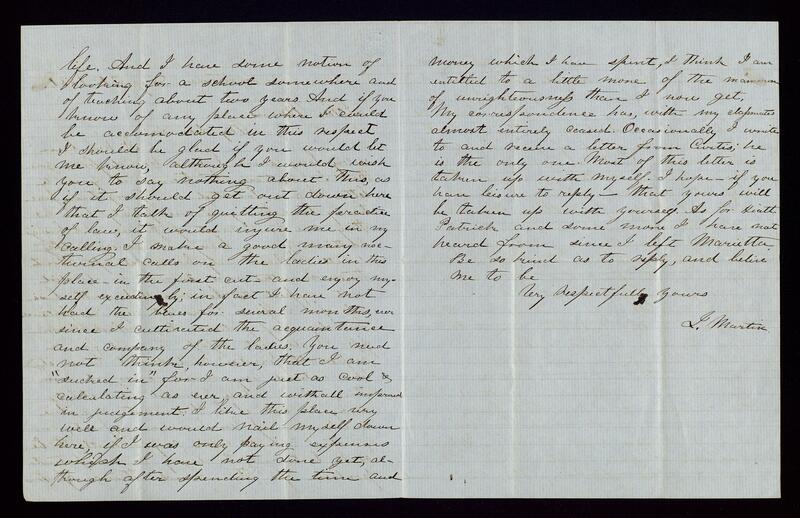 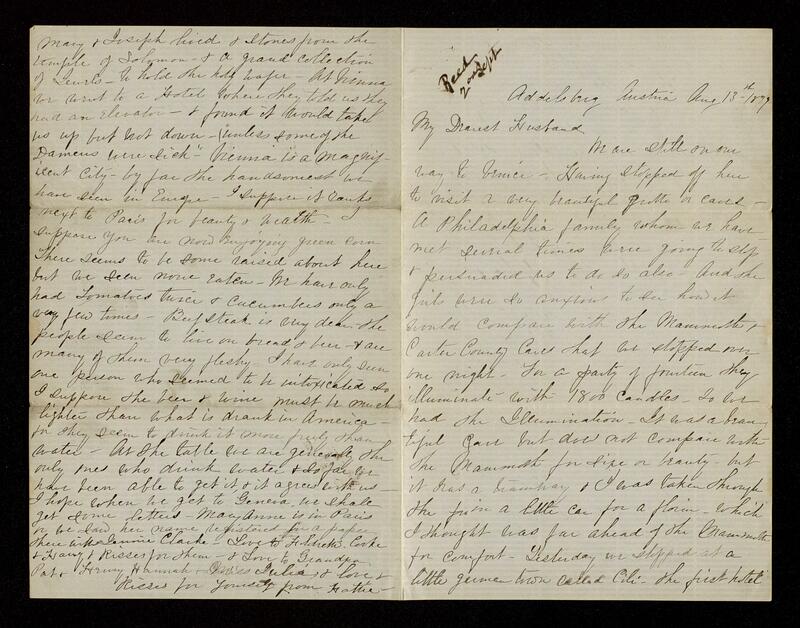 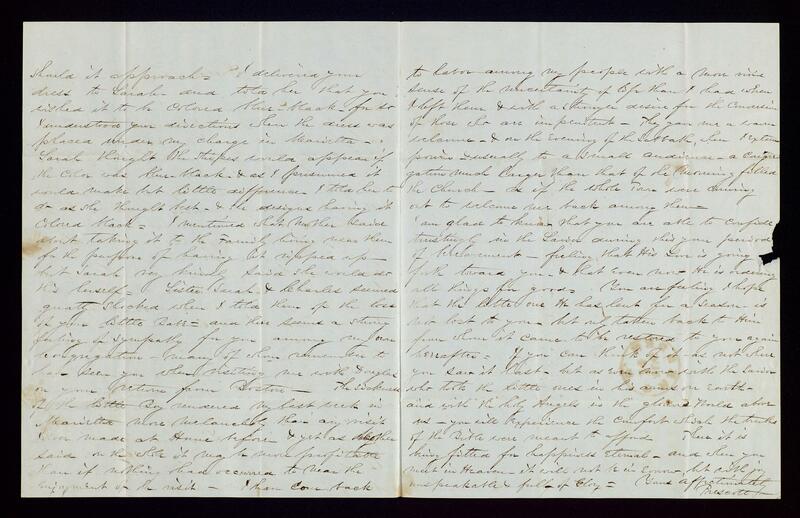 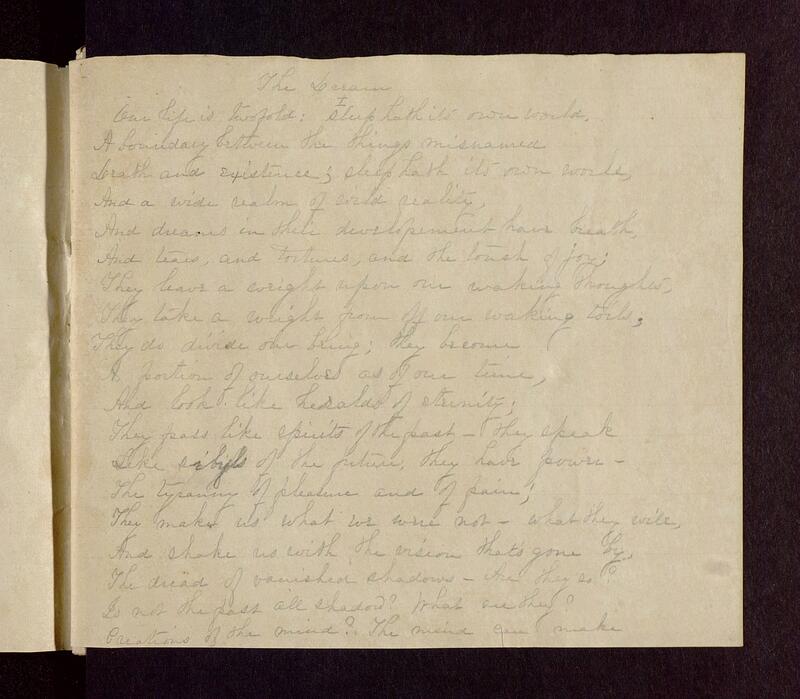 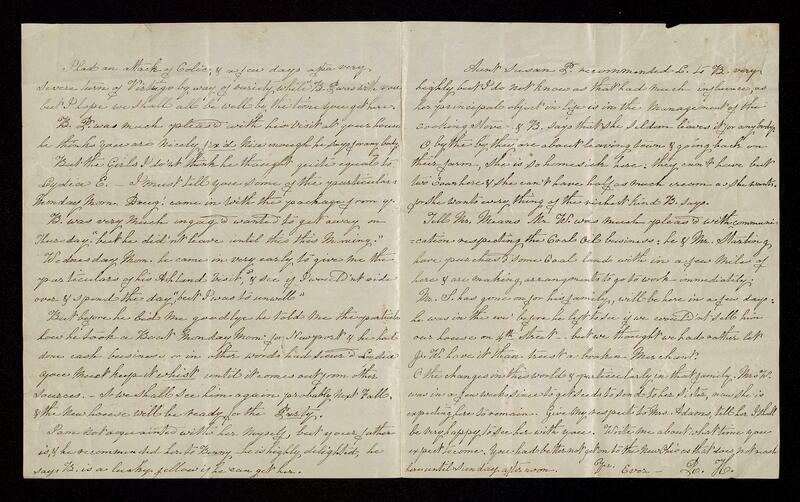 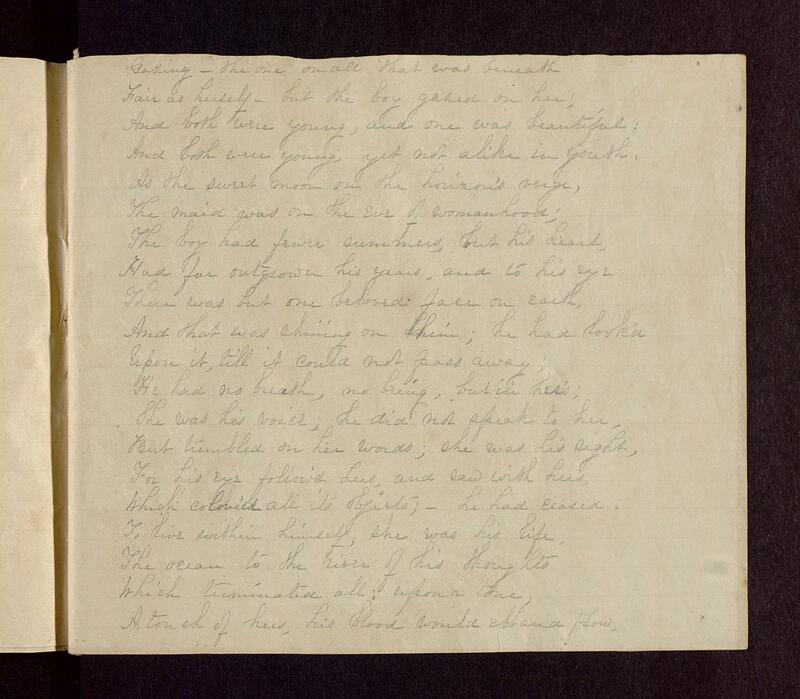 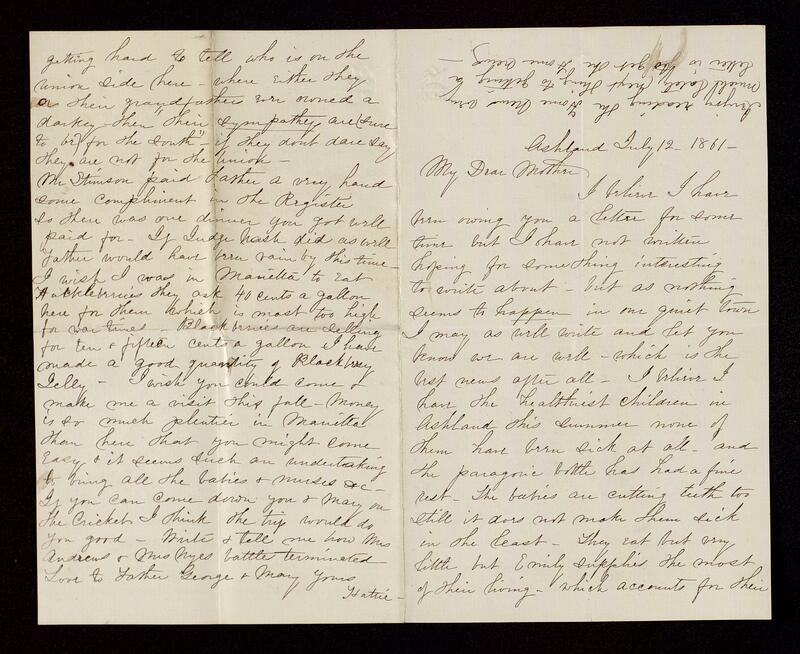 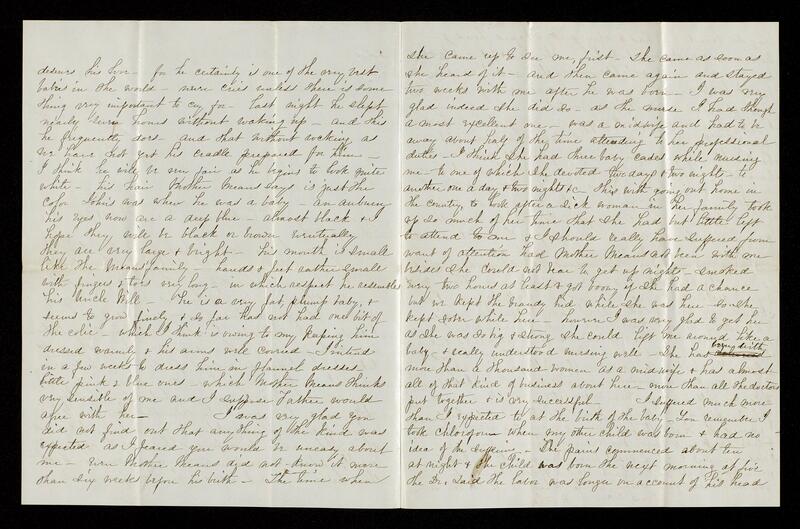 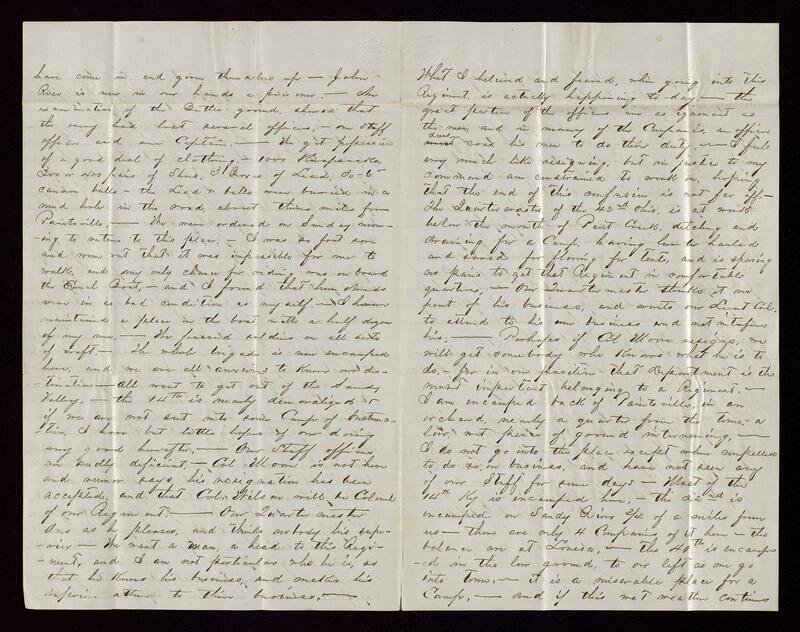 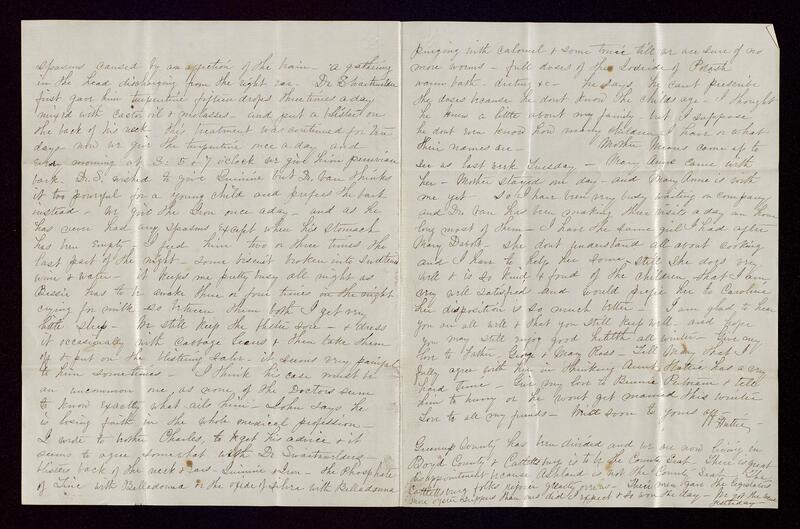 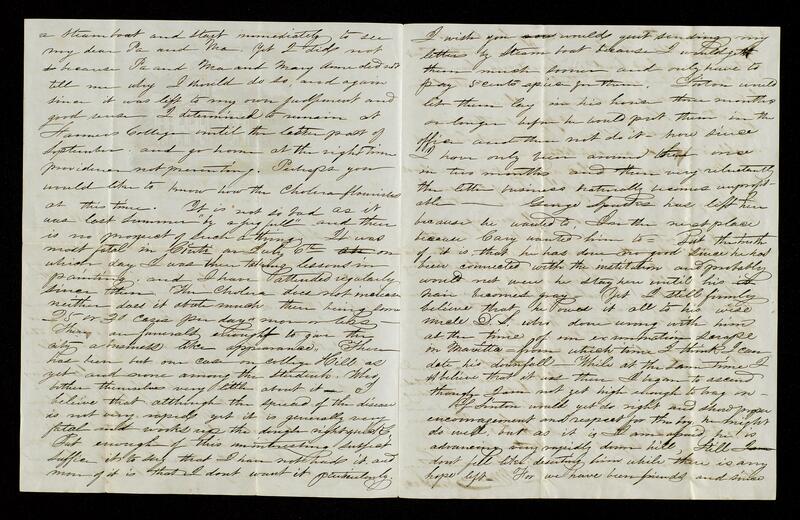 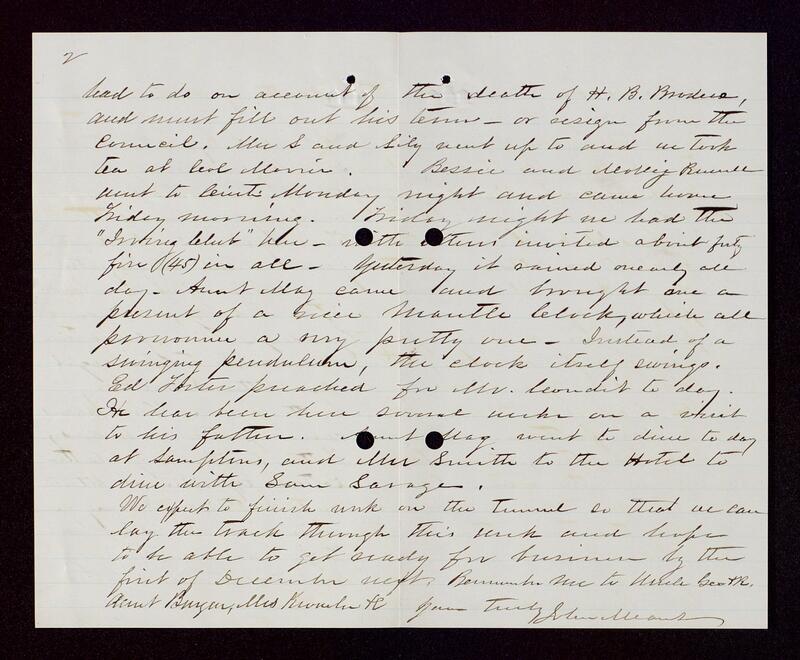 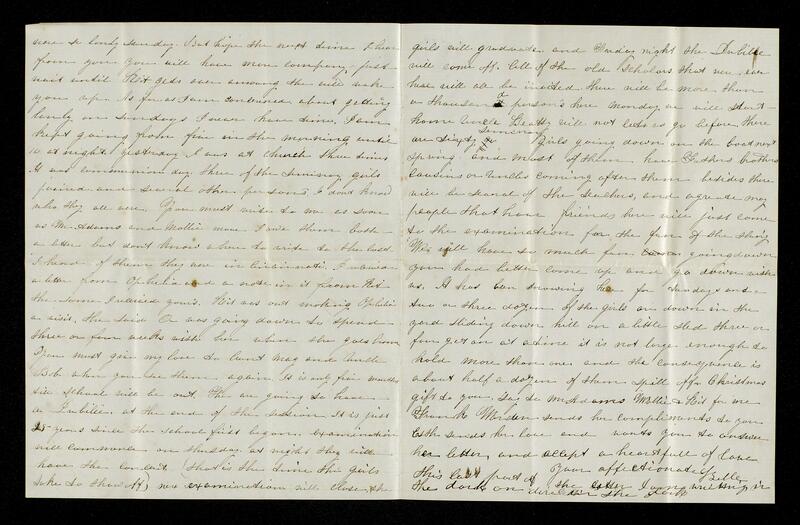 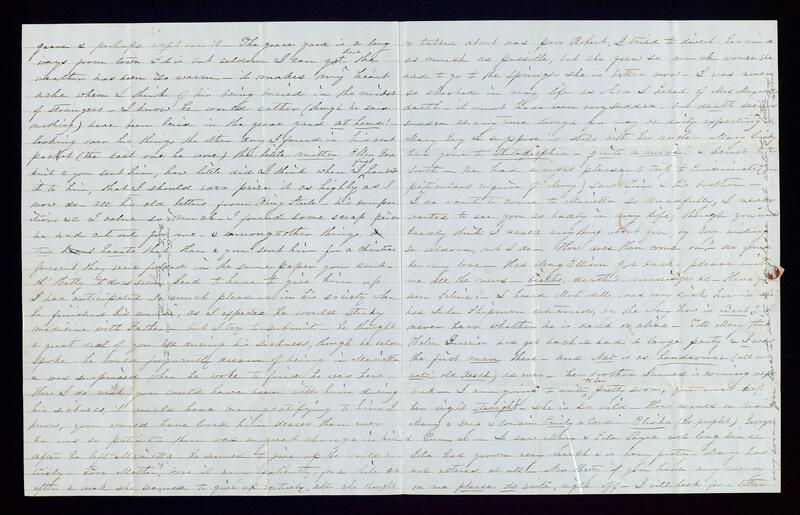 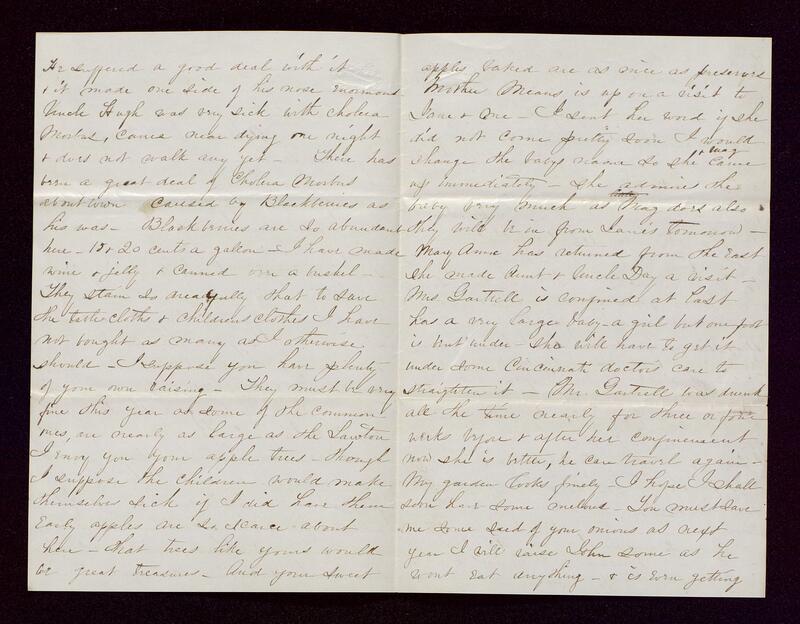 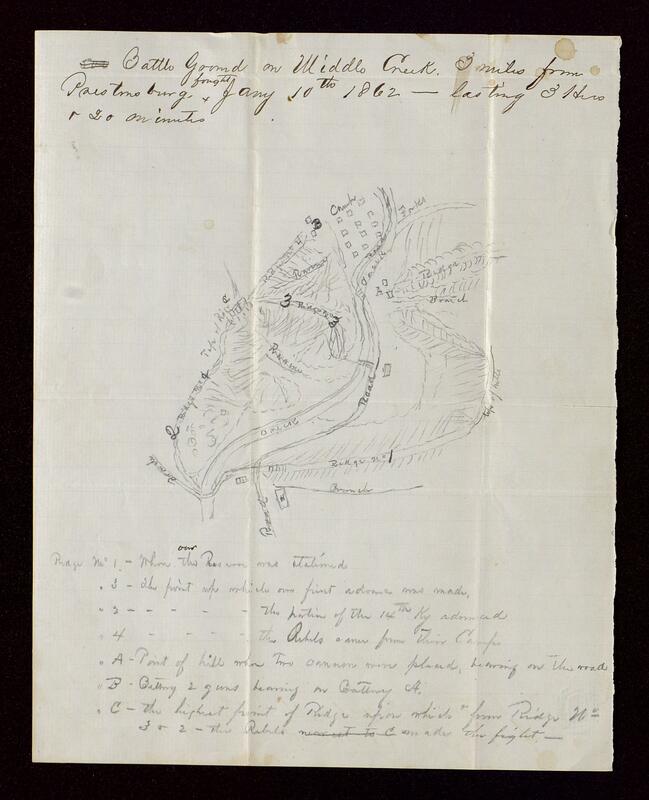 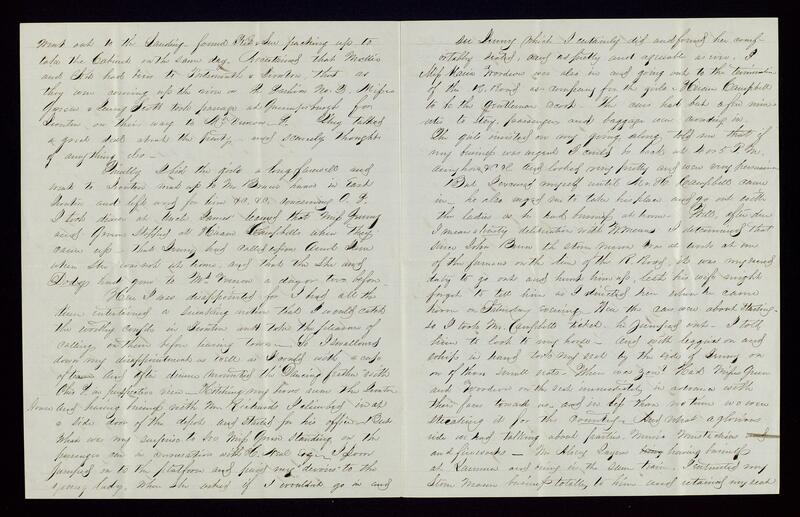 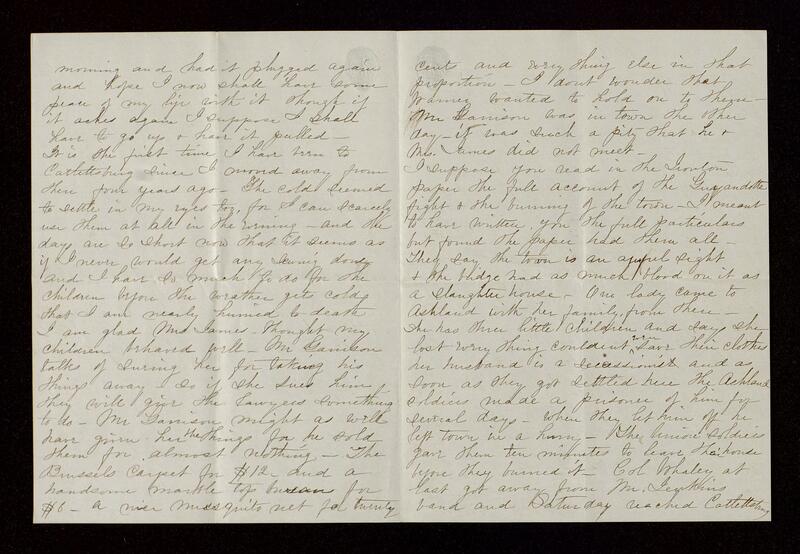 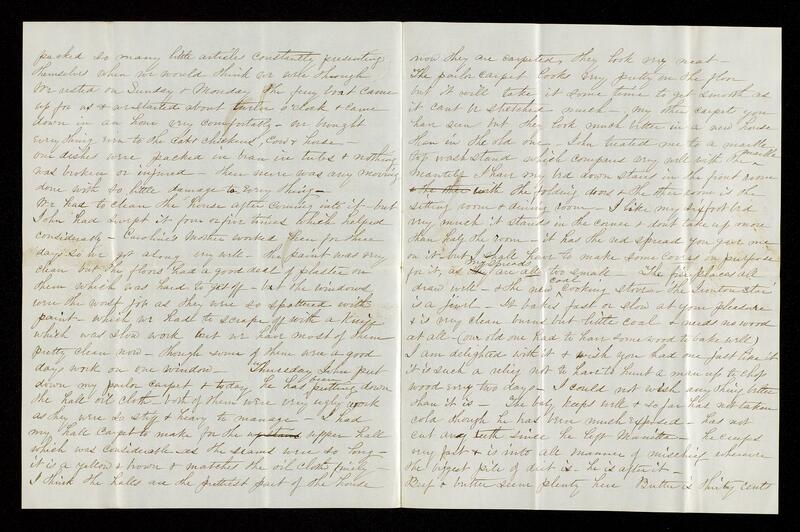 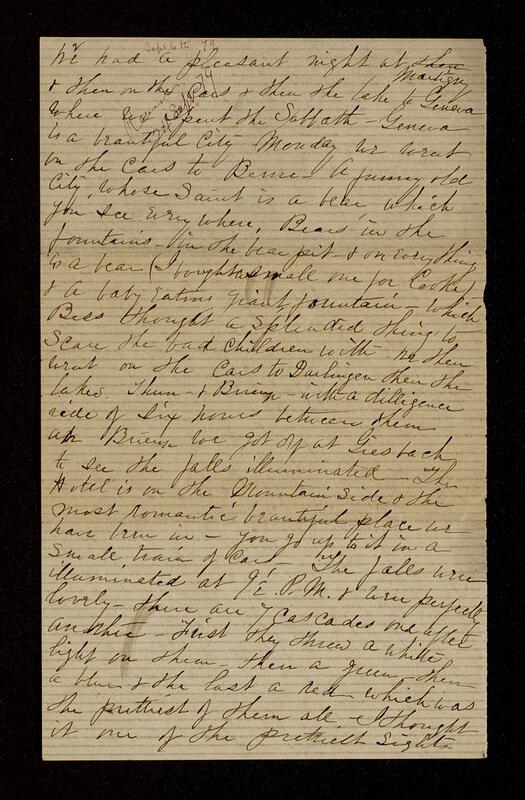 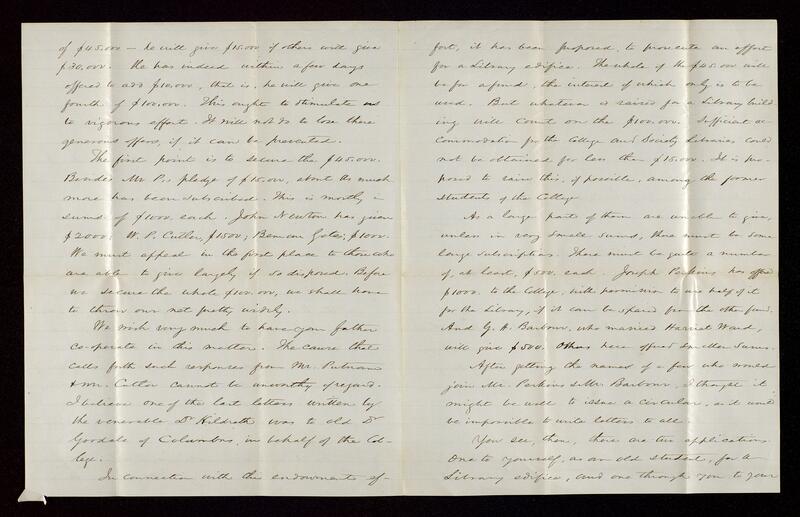 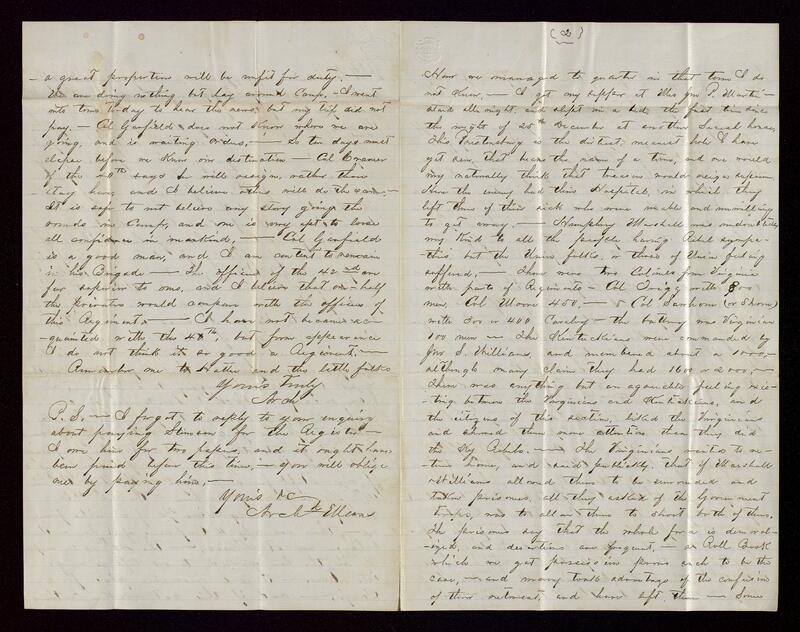 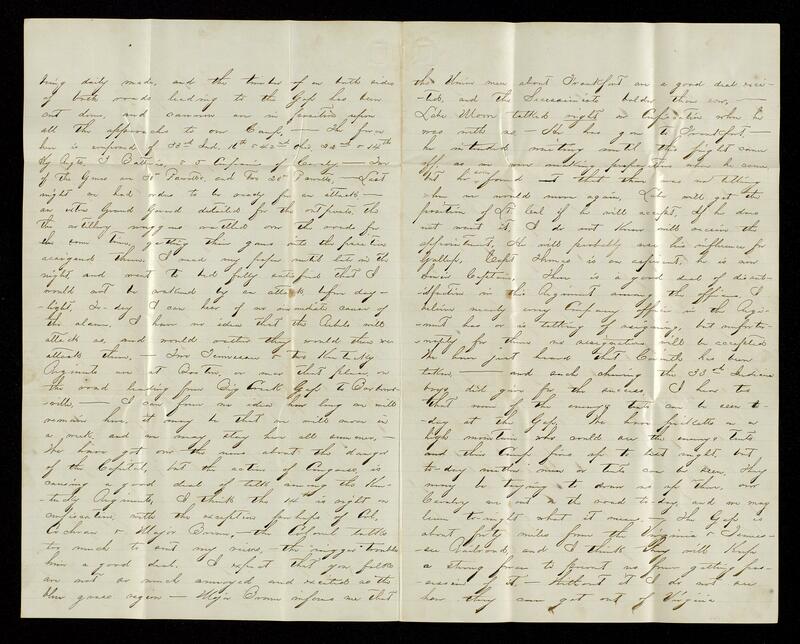 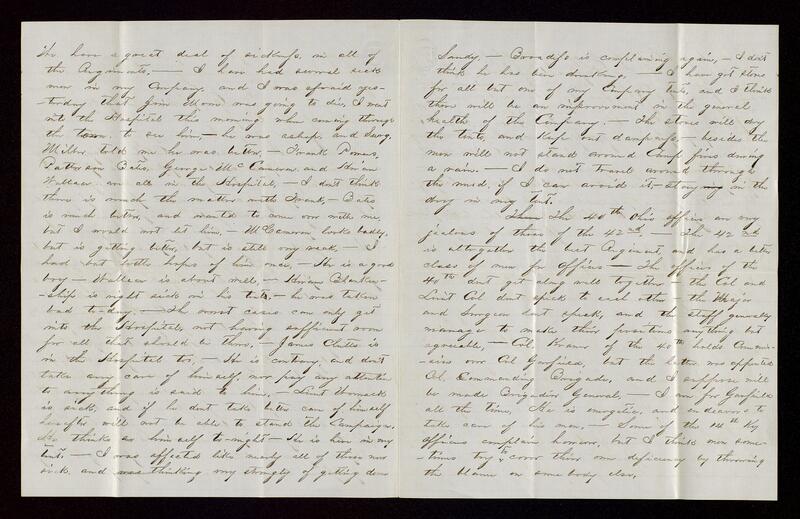 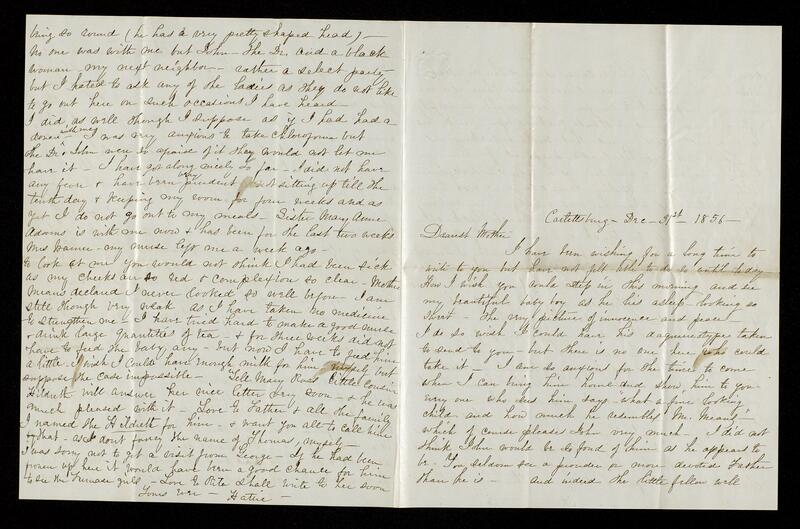 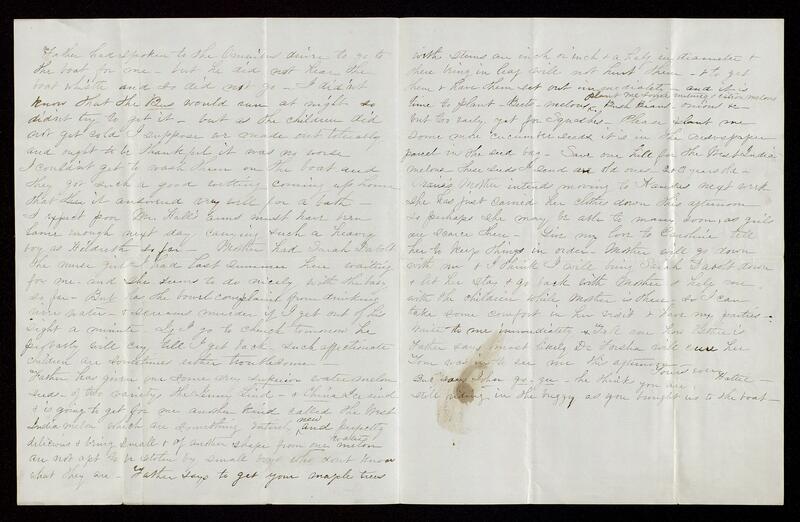 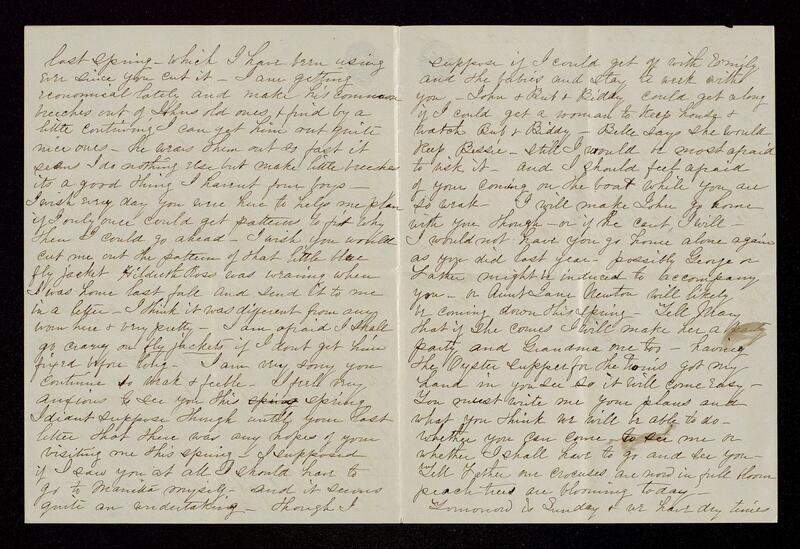 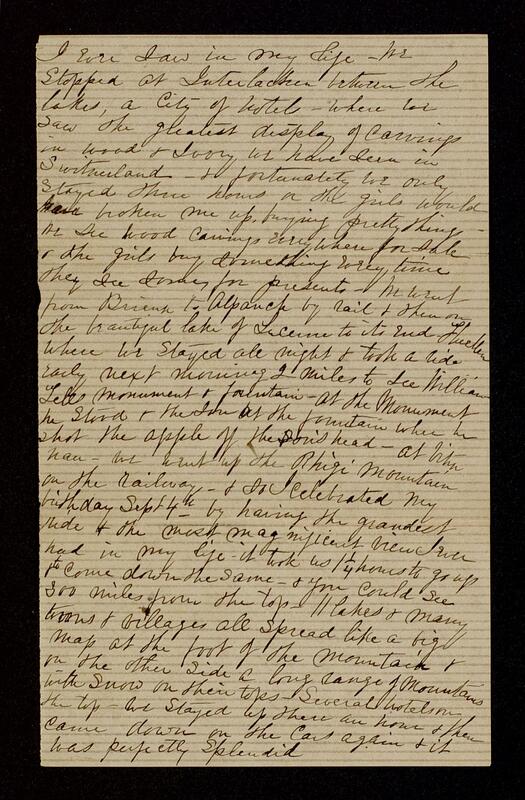 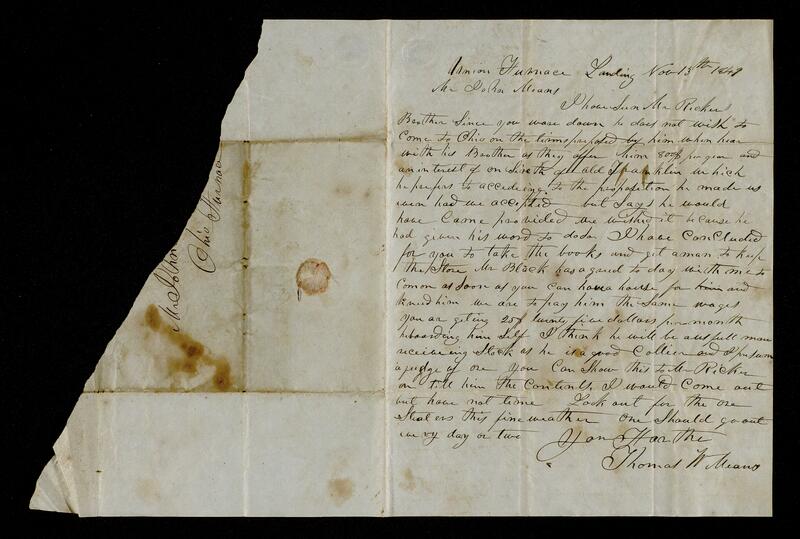 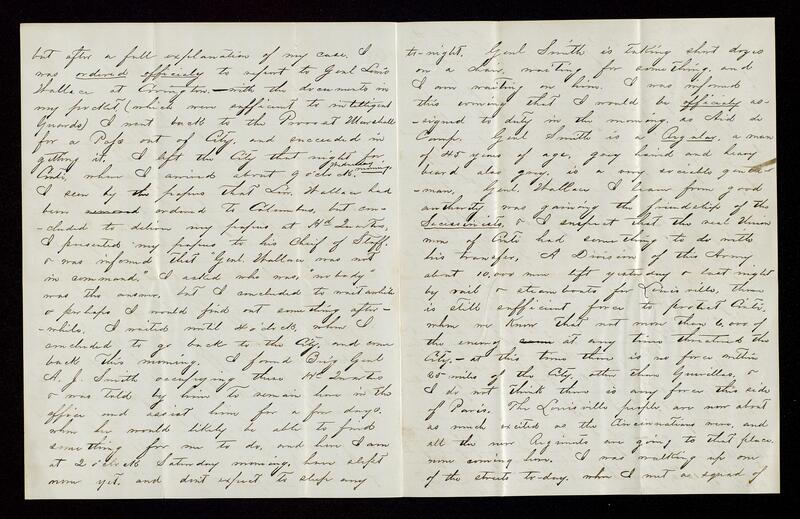 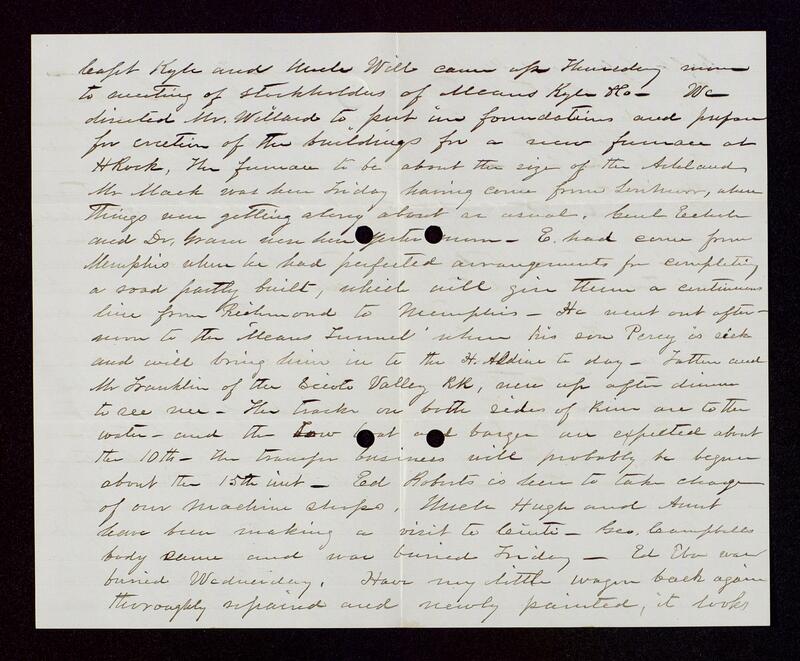 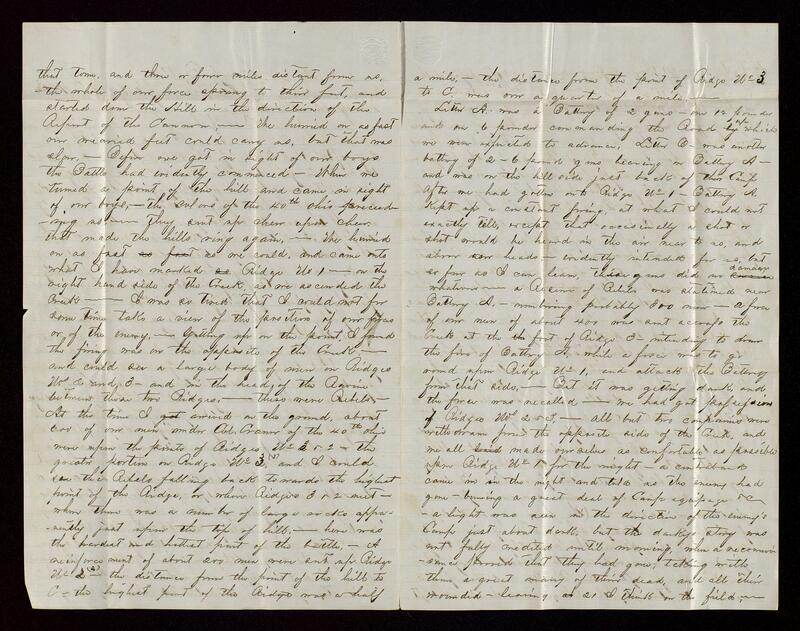 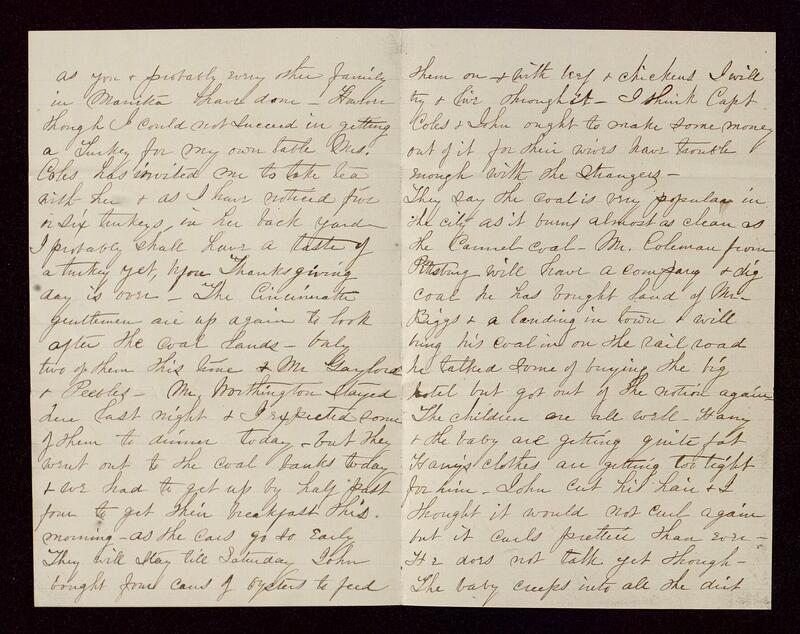 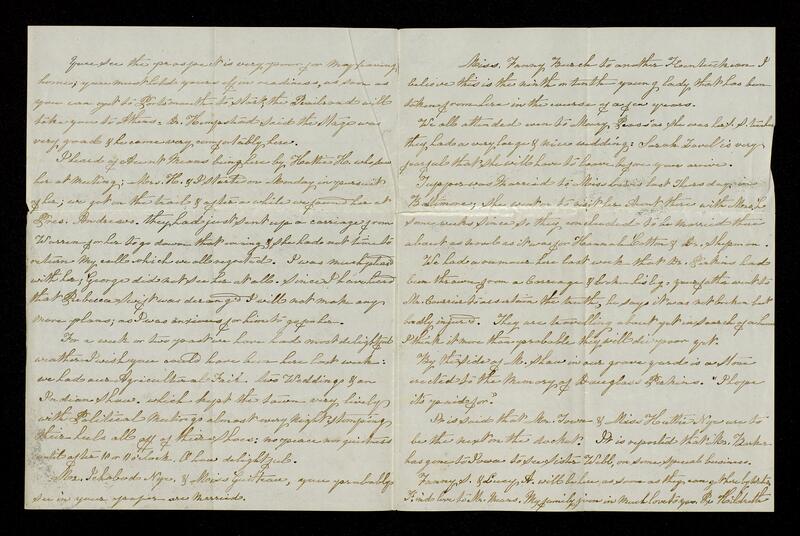 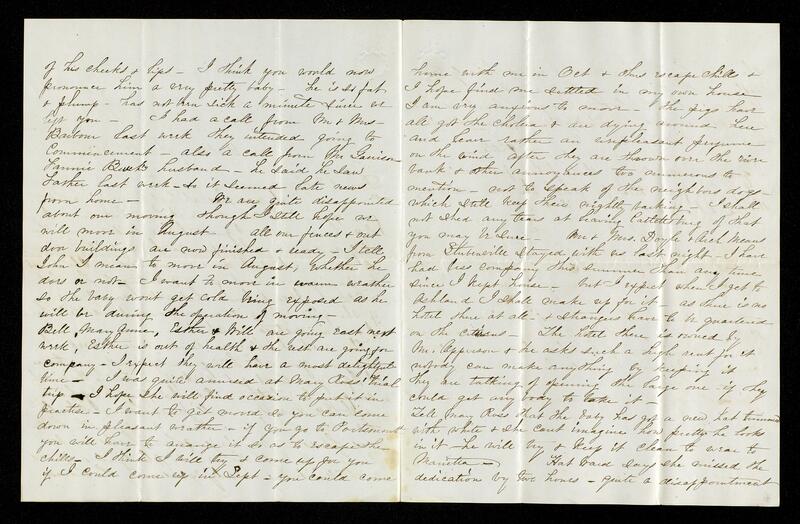 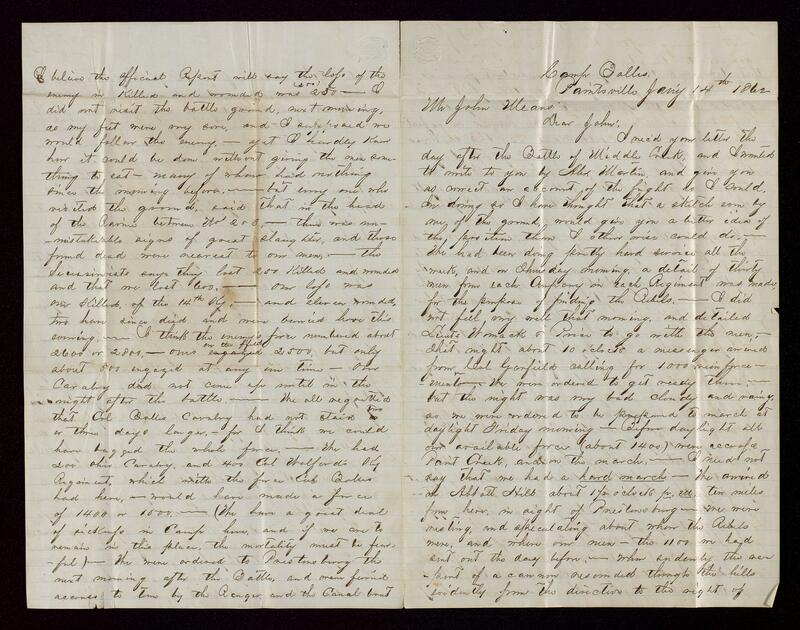 His letters relate in detail the fighting around Prestonsburg, Kentucky in January 1862 and the flight of rebel forces south through the Cumberland Gap into Tennessee. 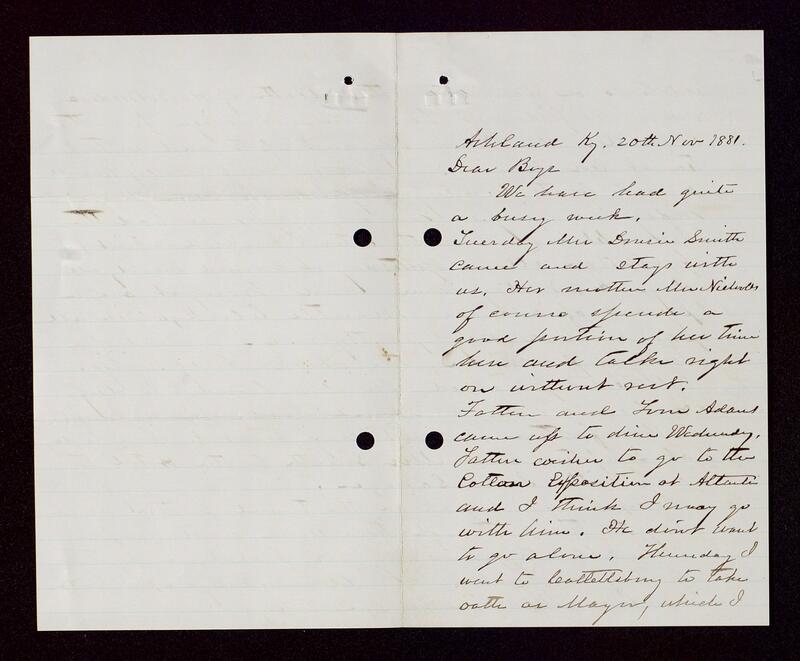 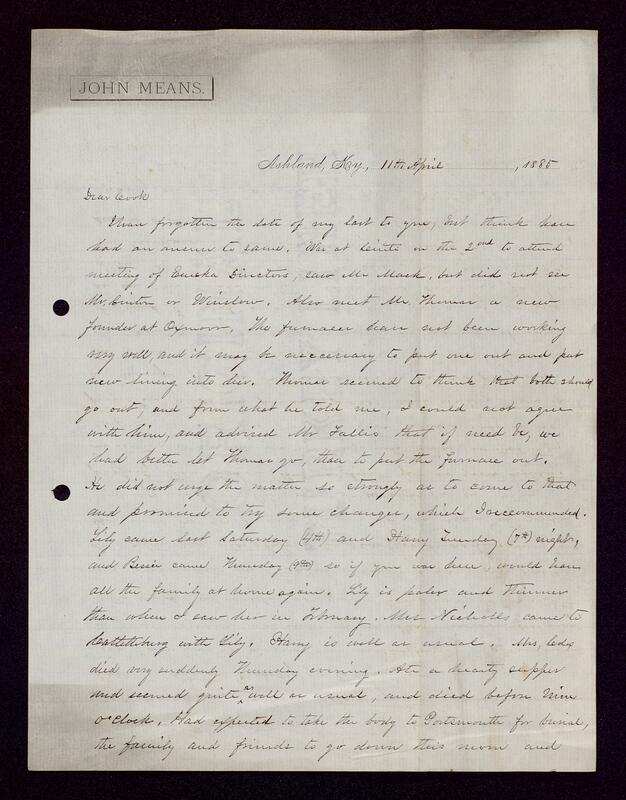 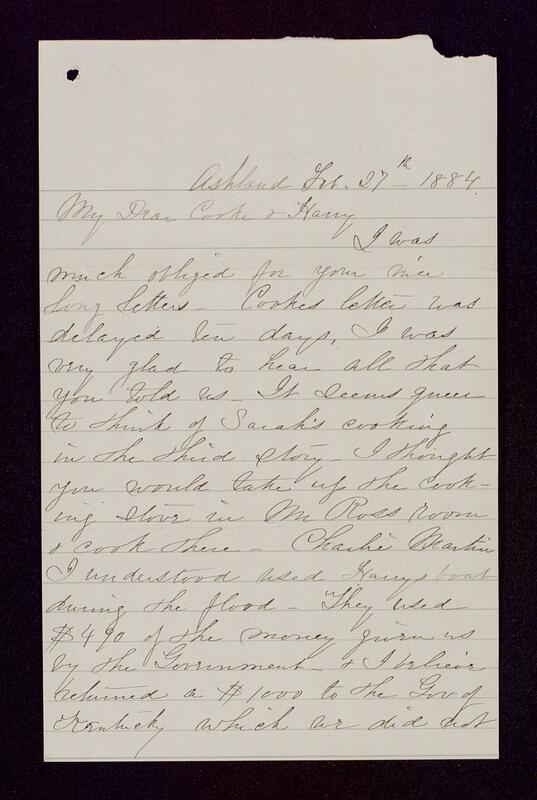 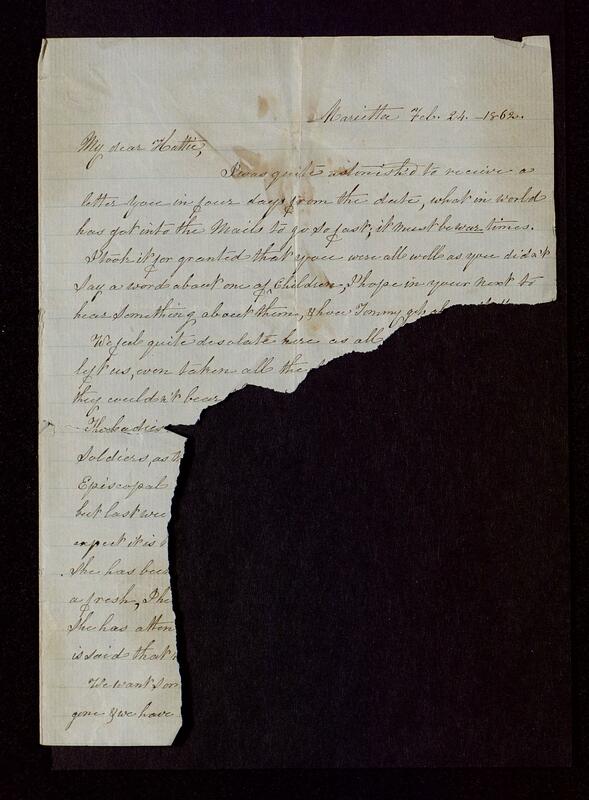 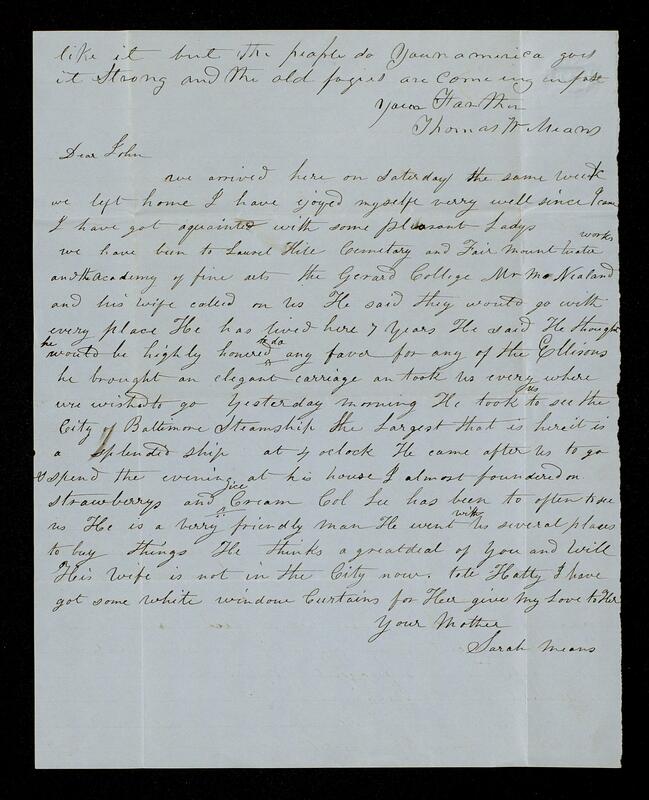 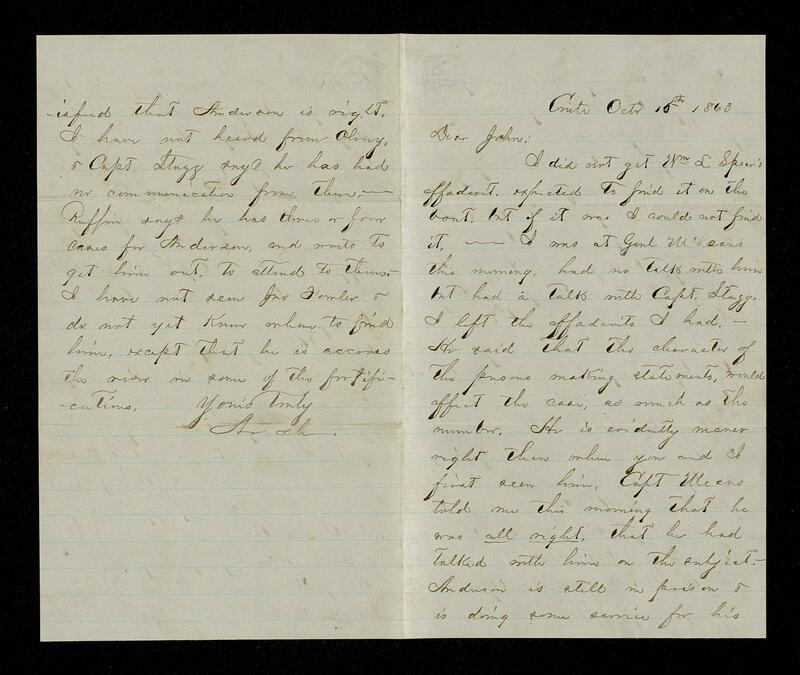 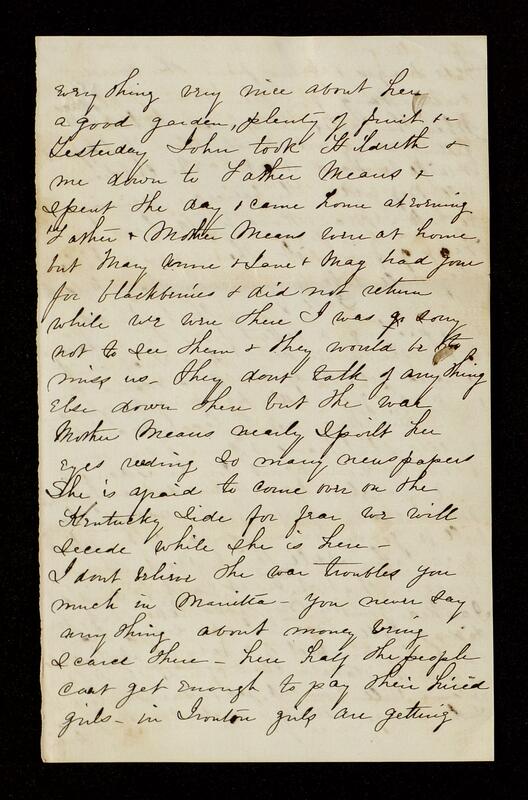 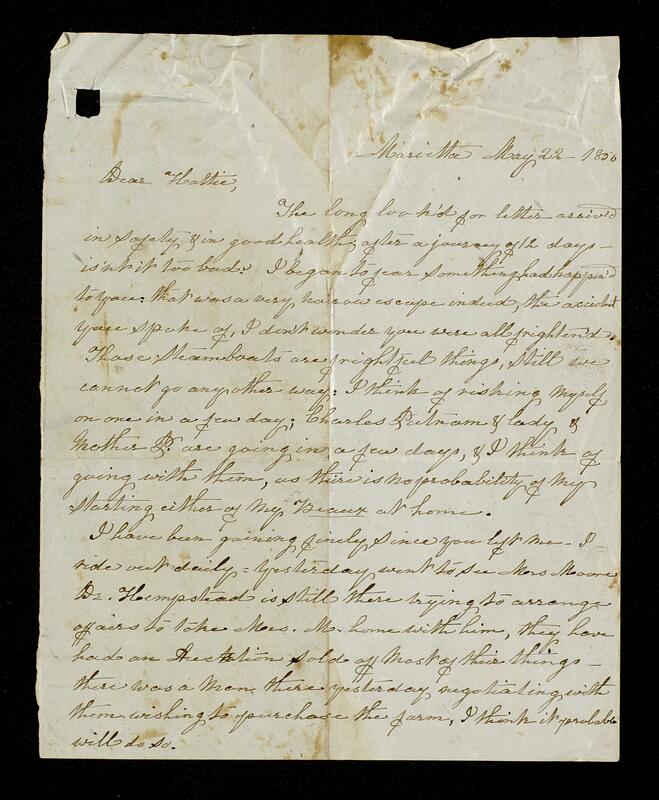 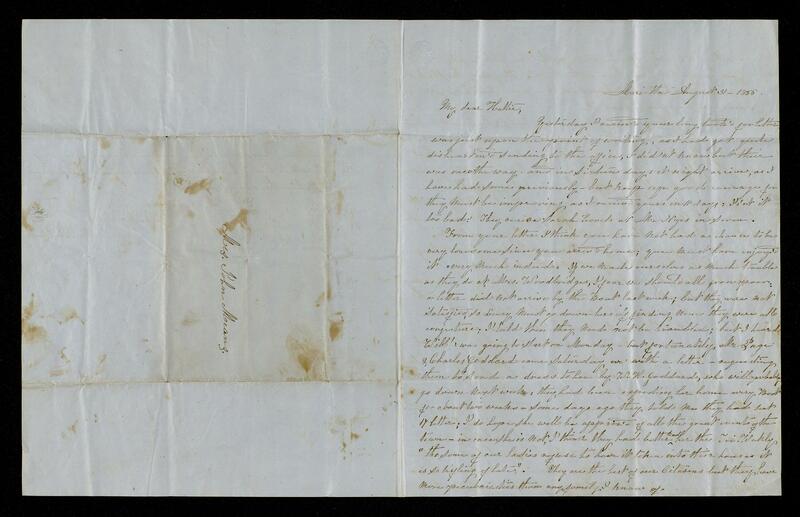 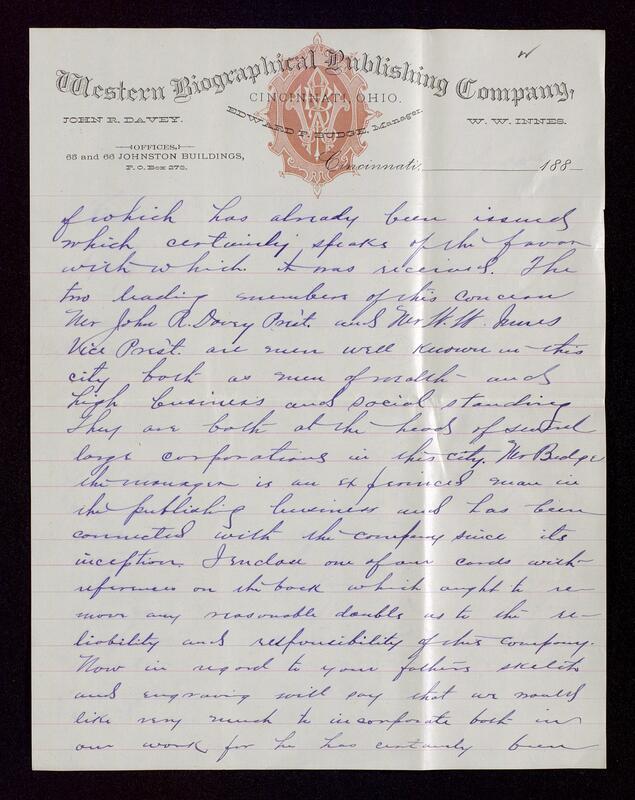 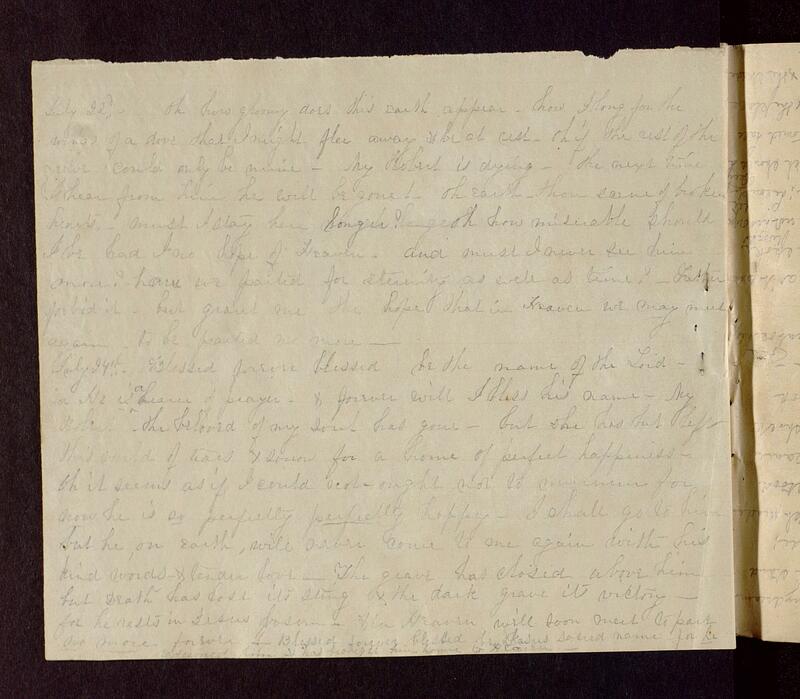 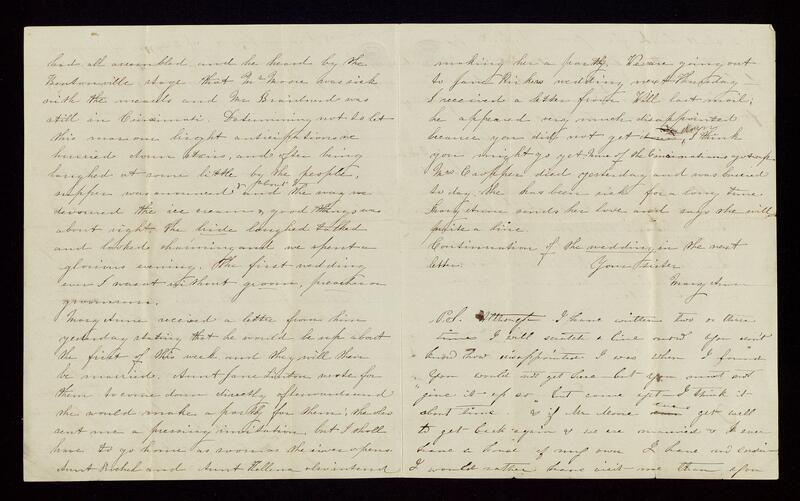 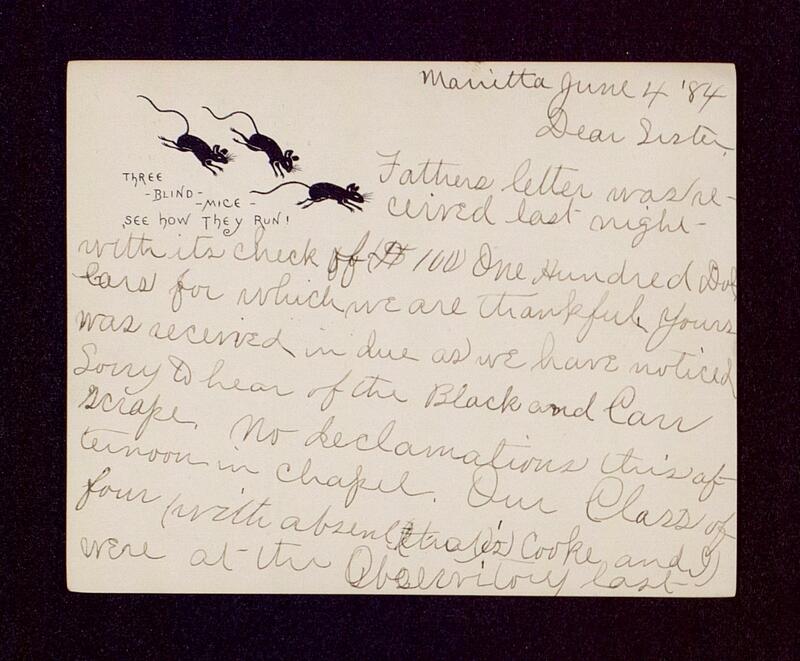 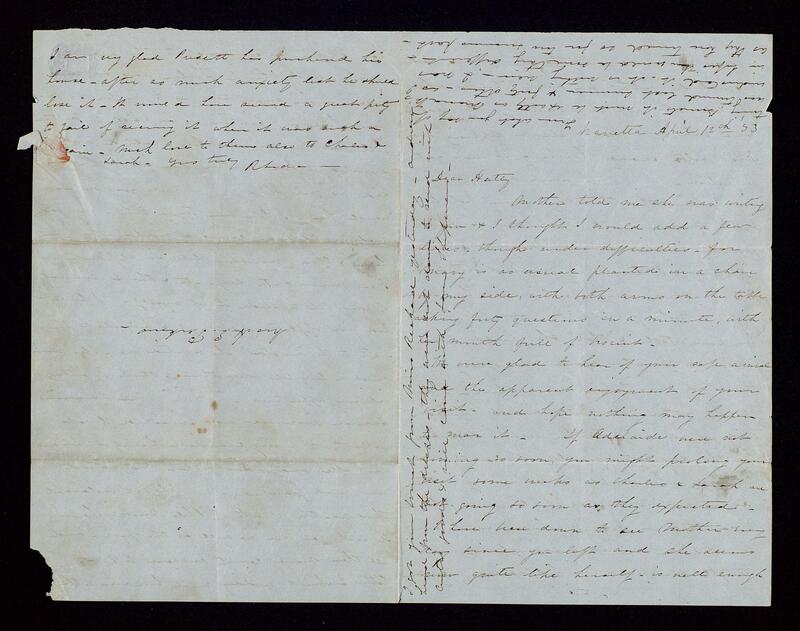 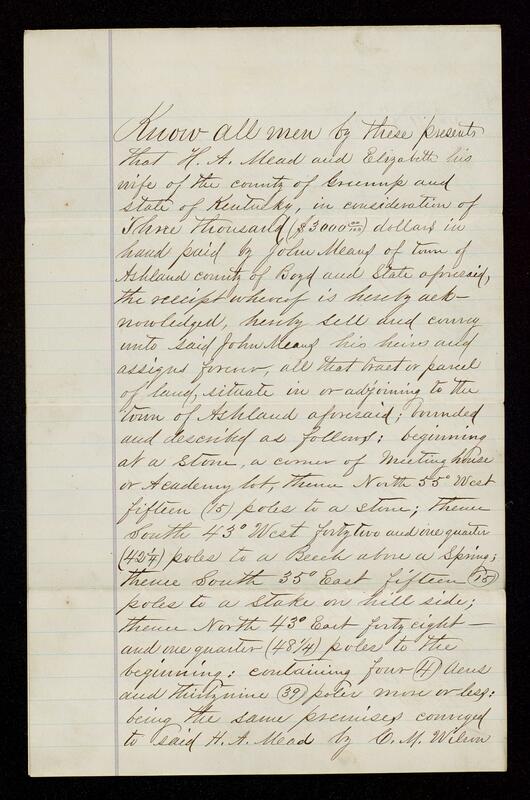 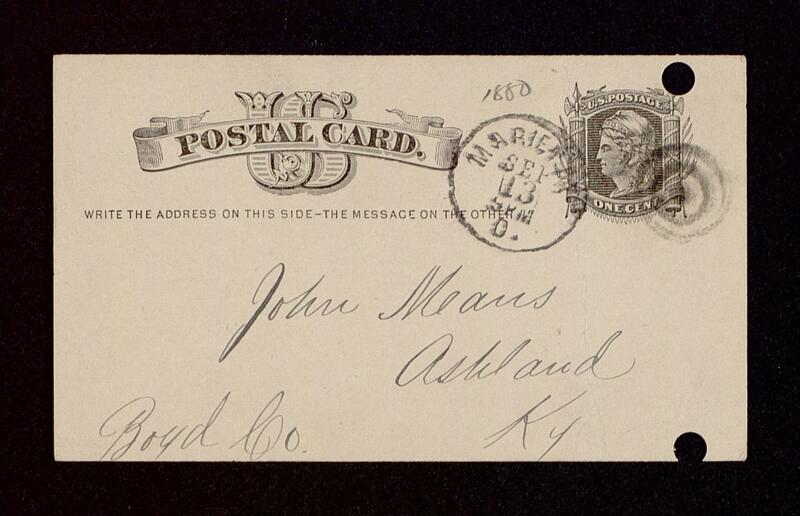 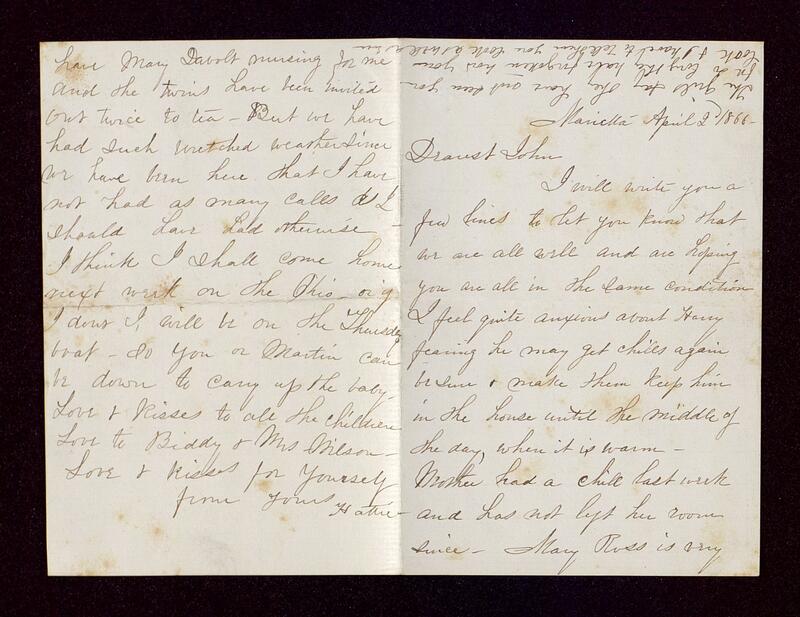 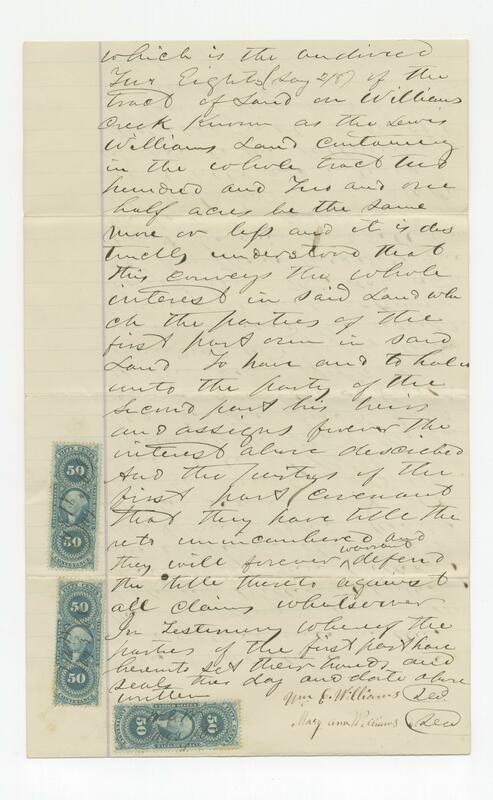 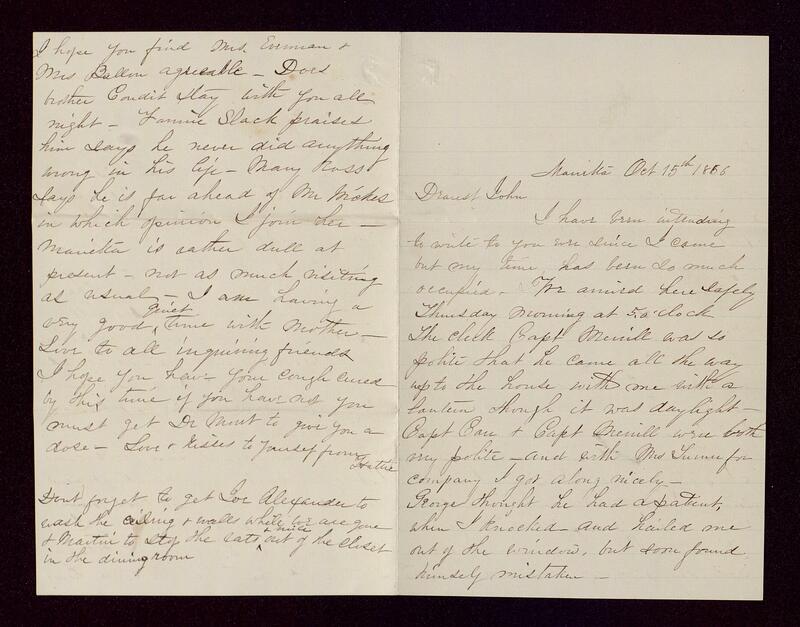 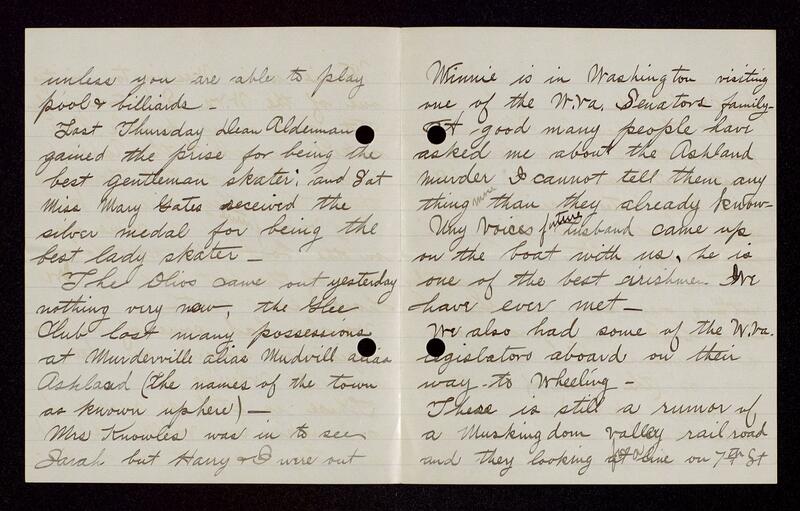 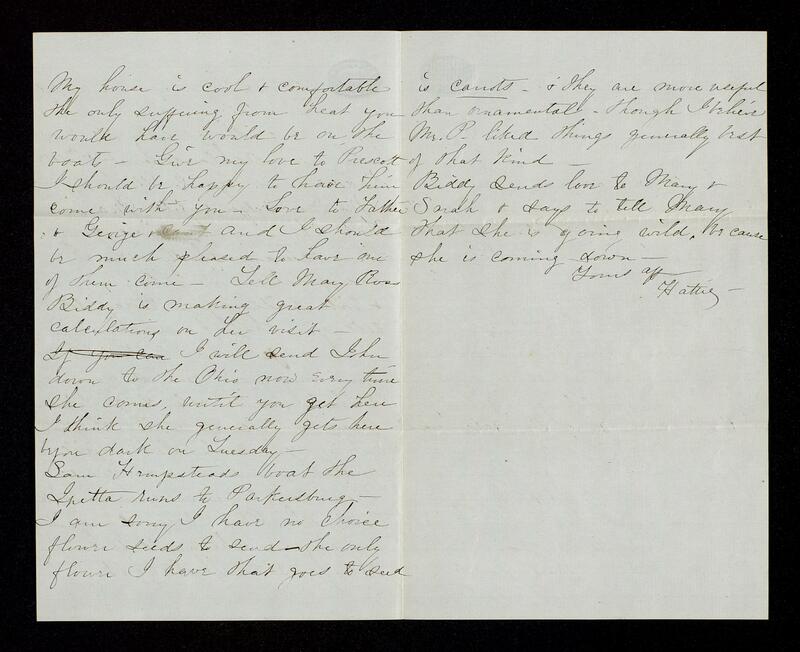 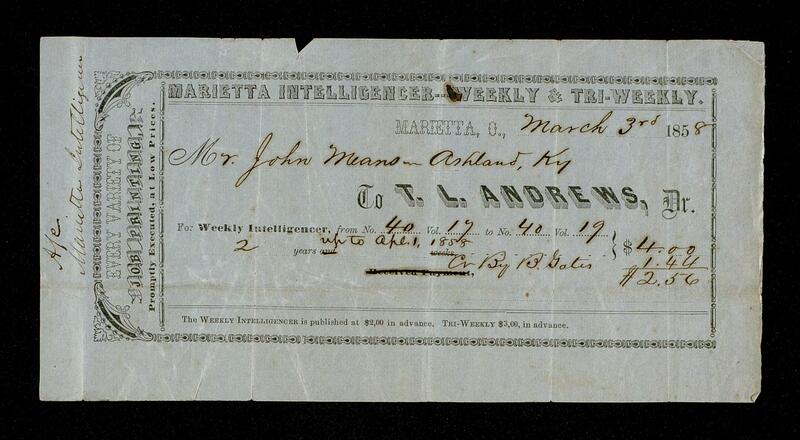 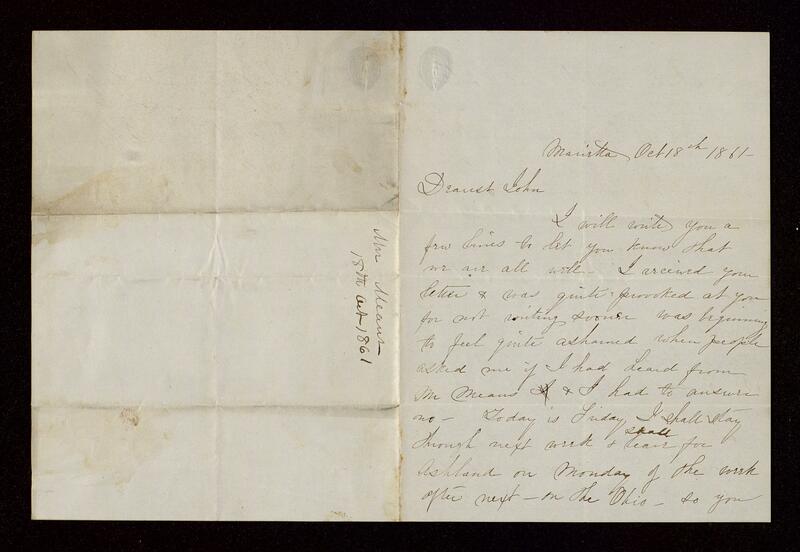 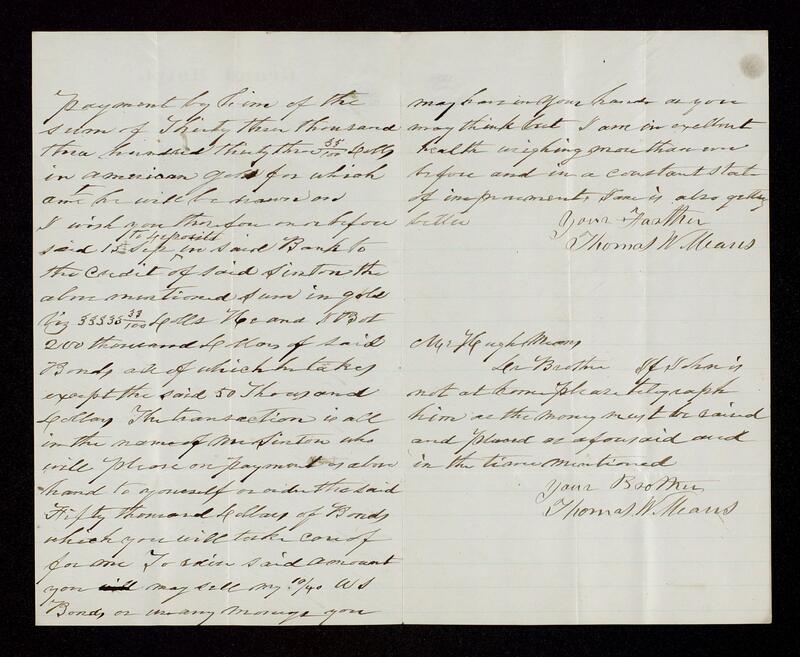 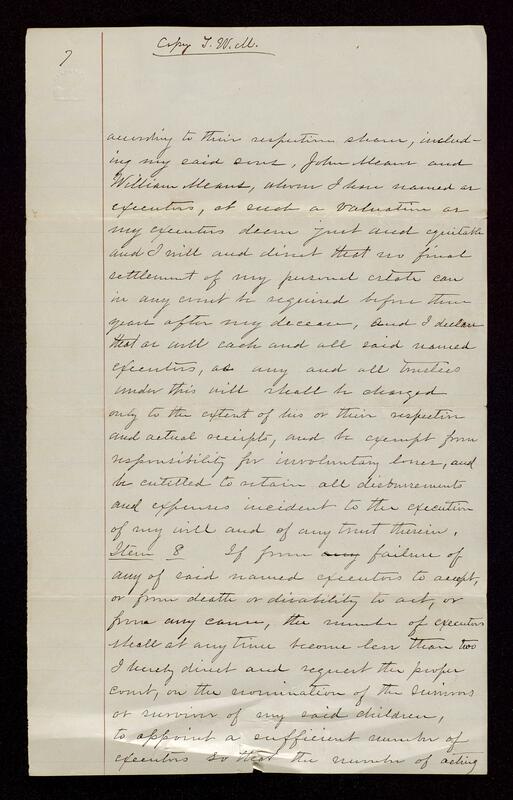 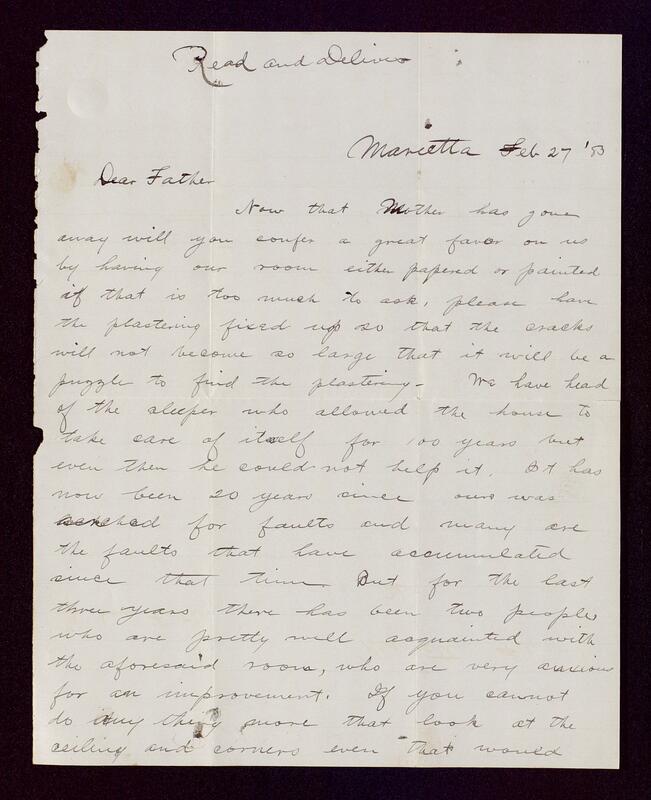 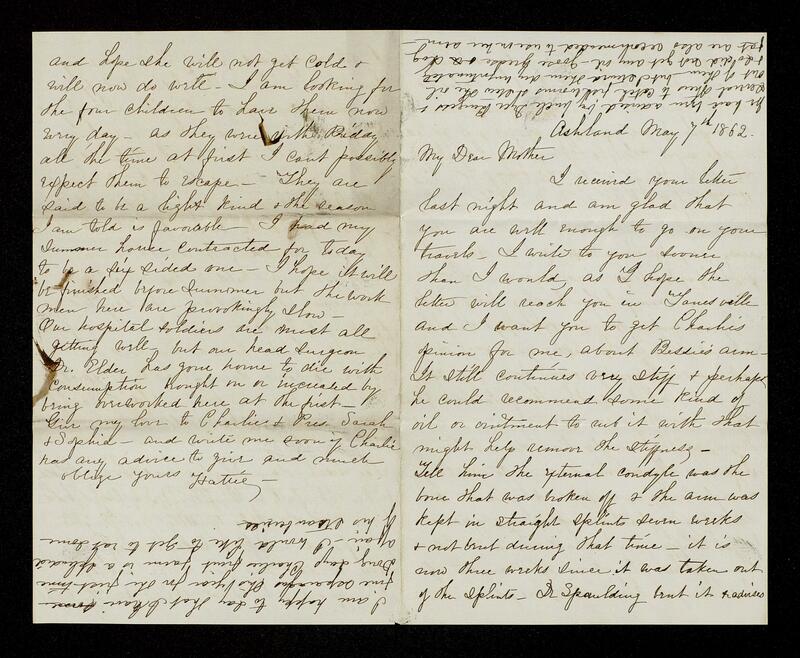 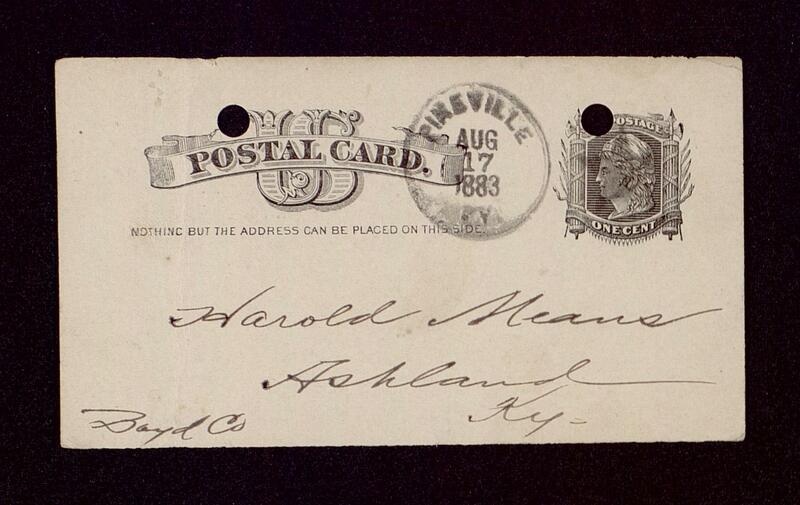 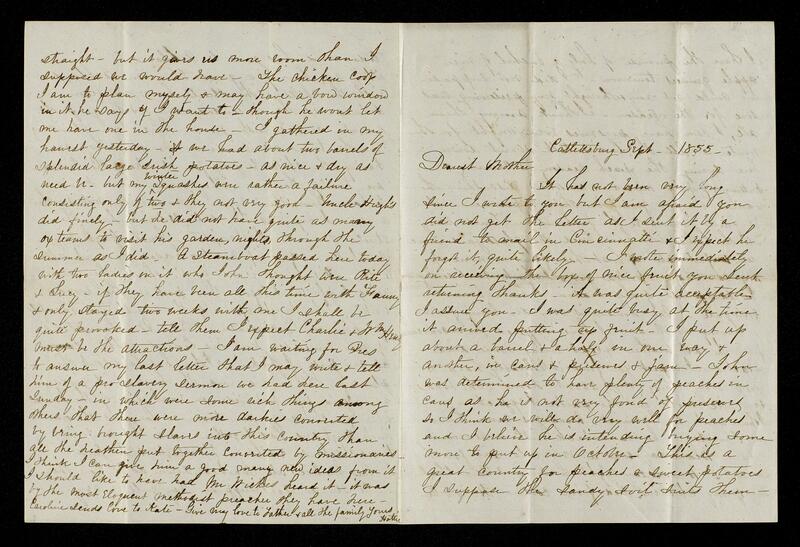 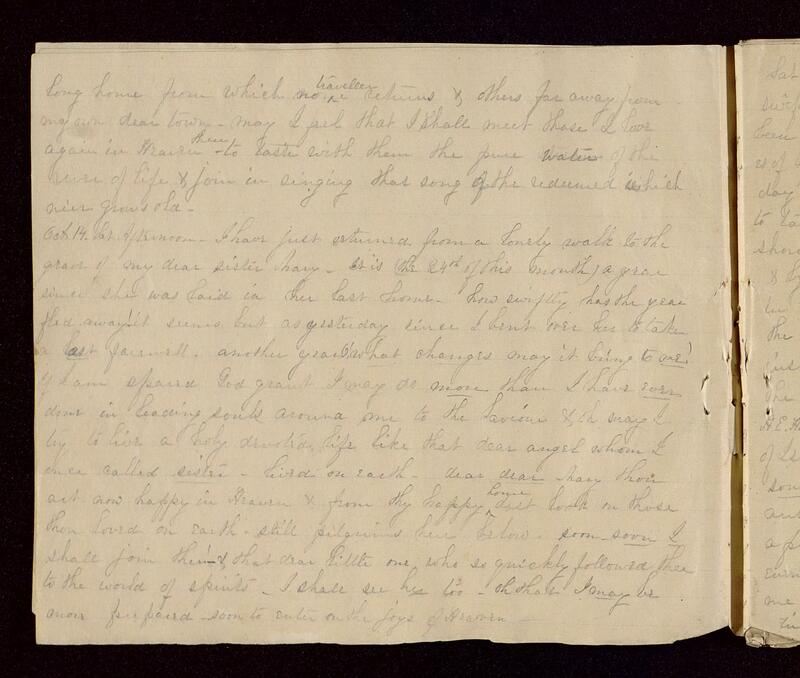 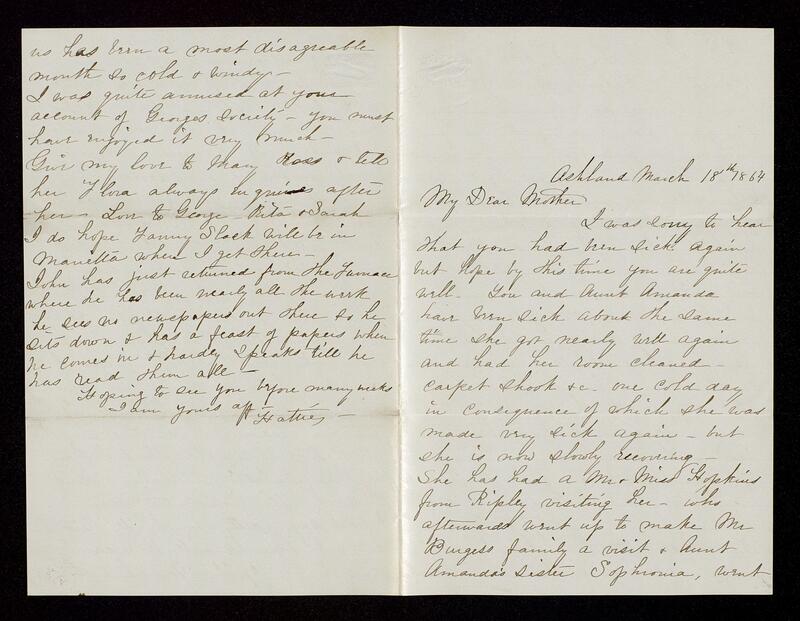 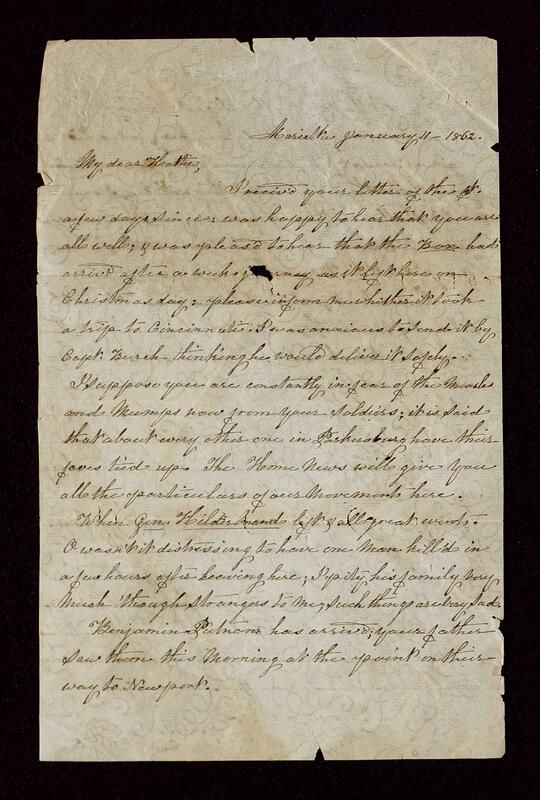 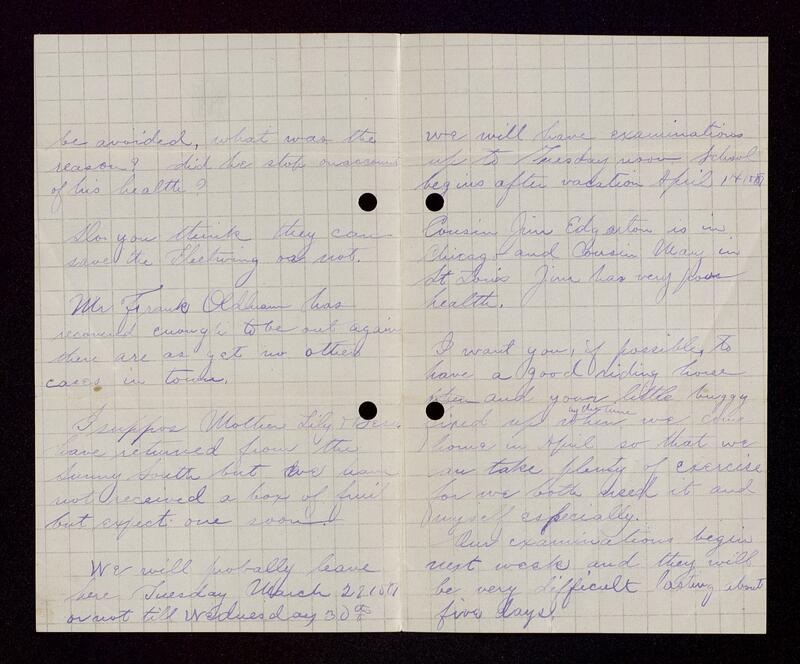 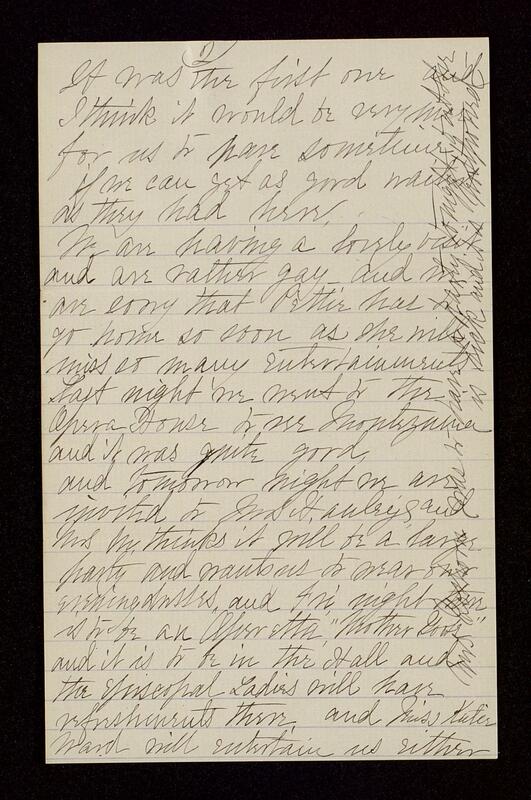 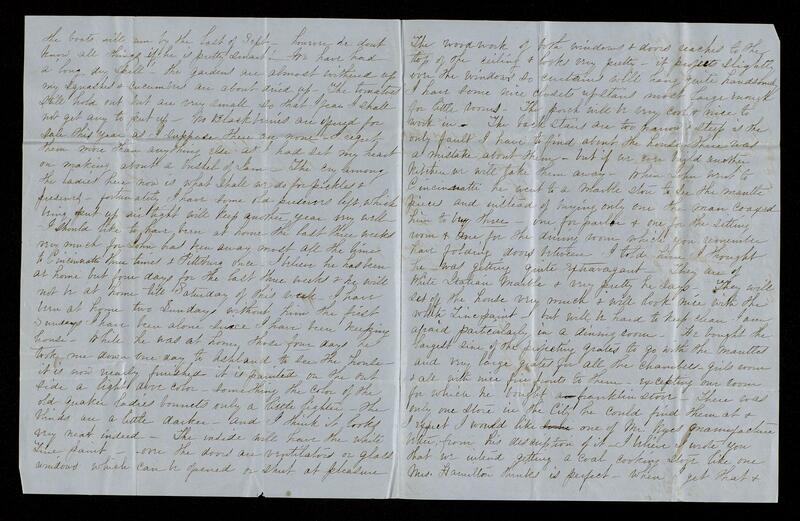 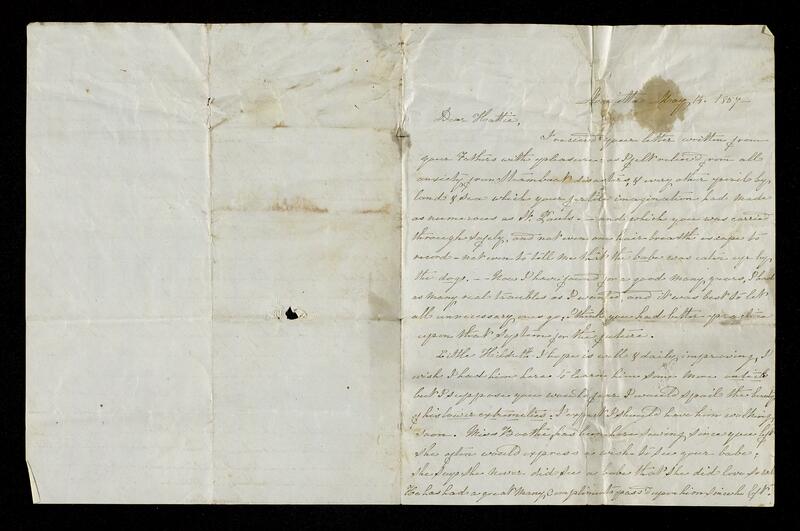 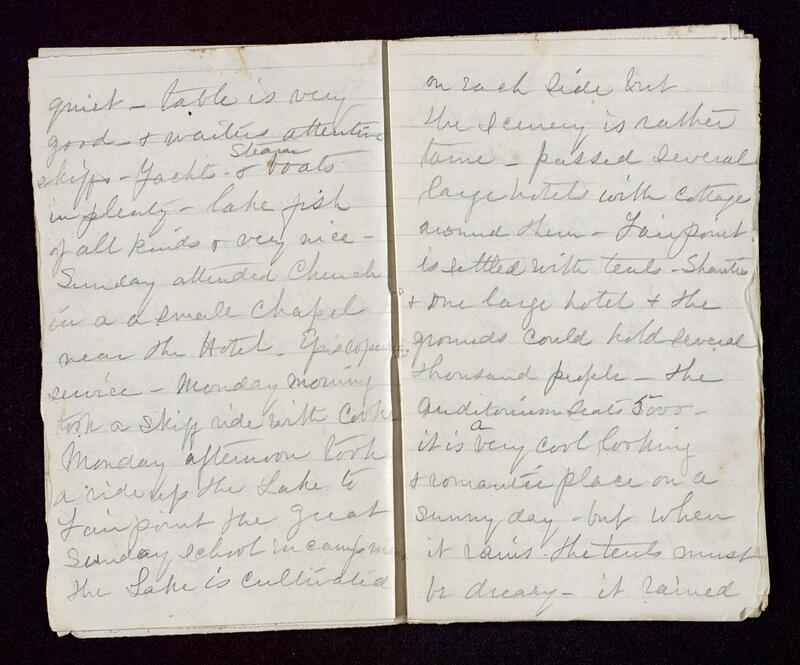 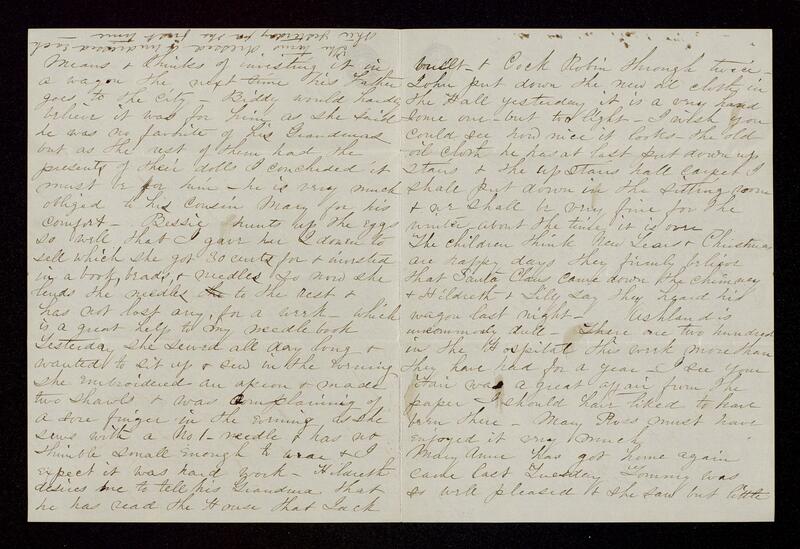 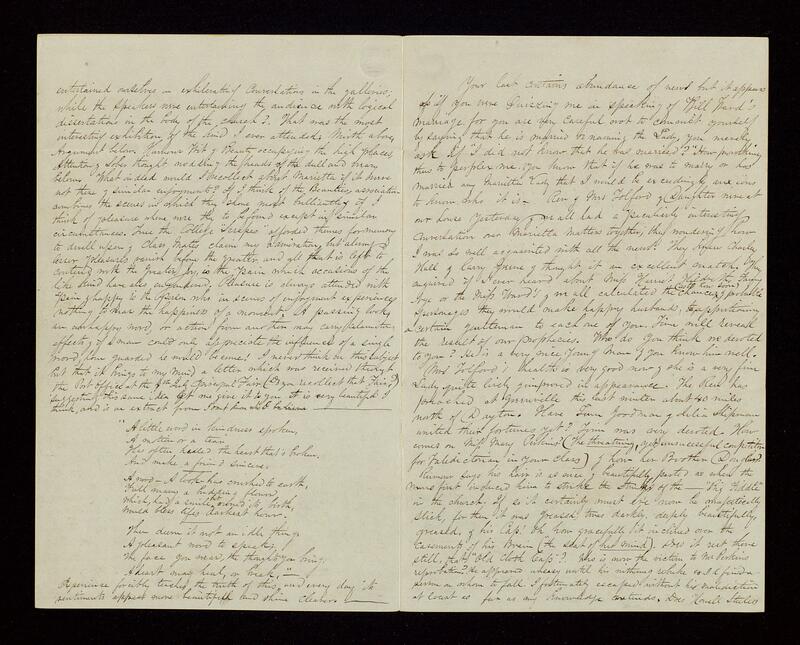 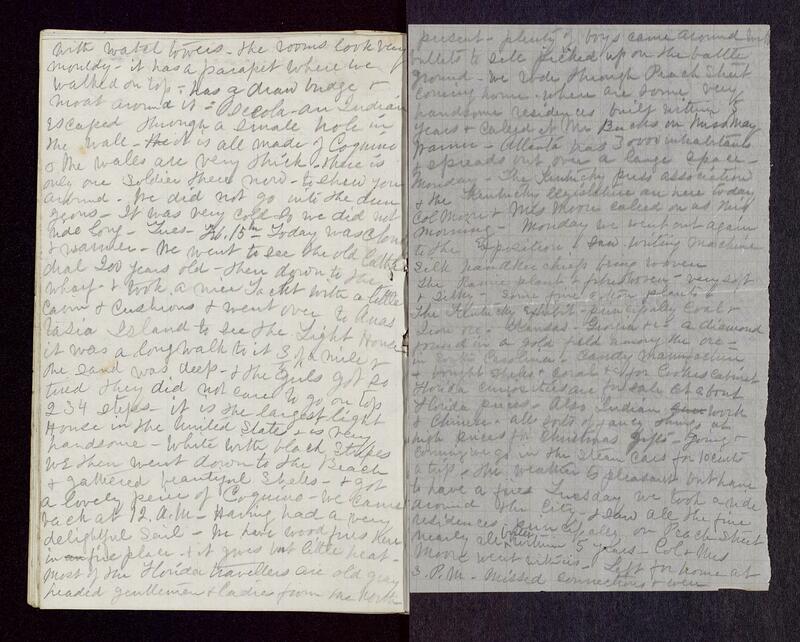 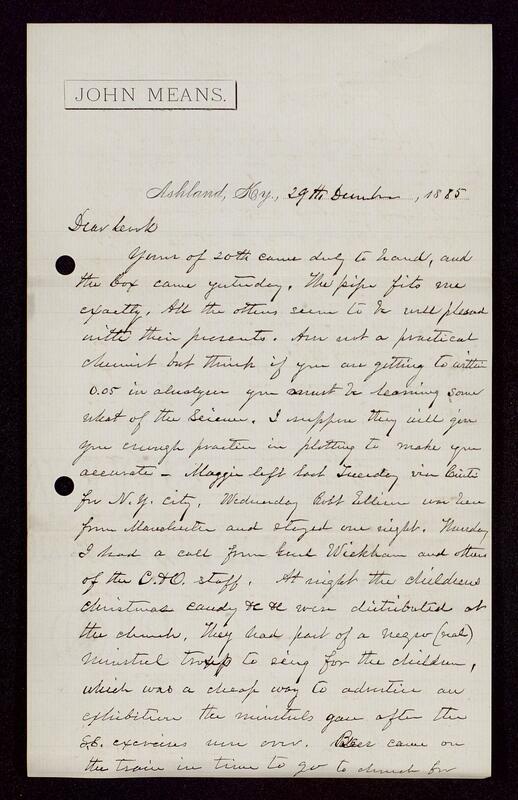 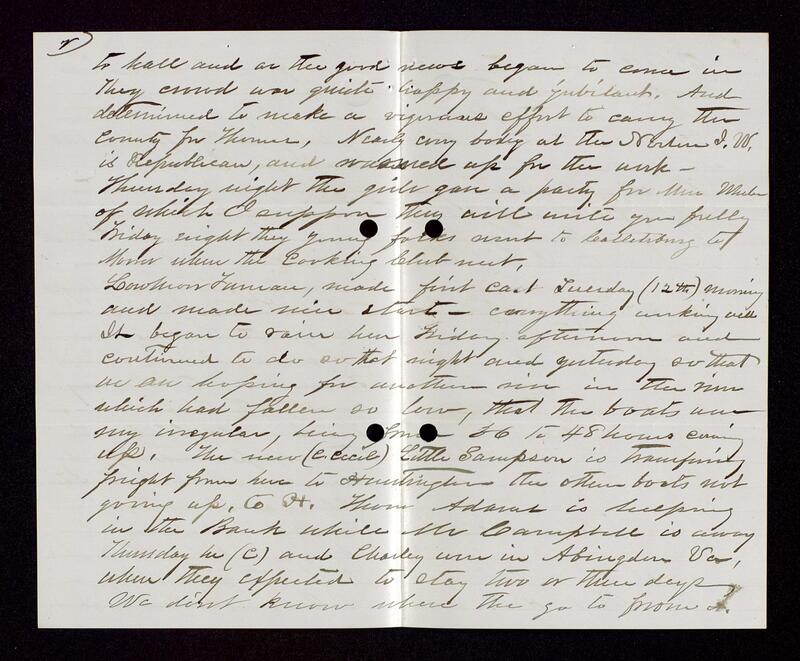 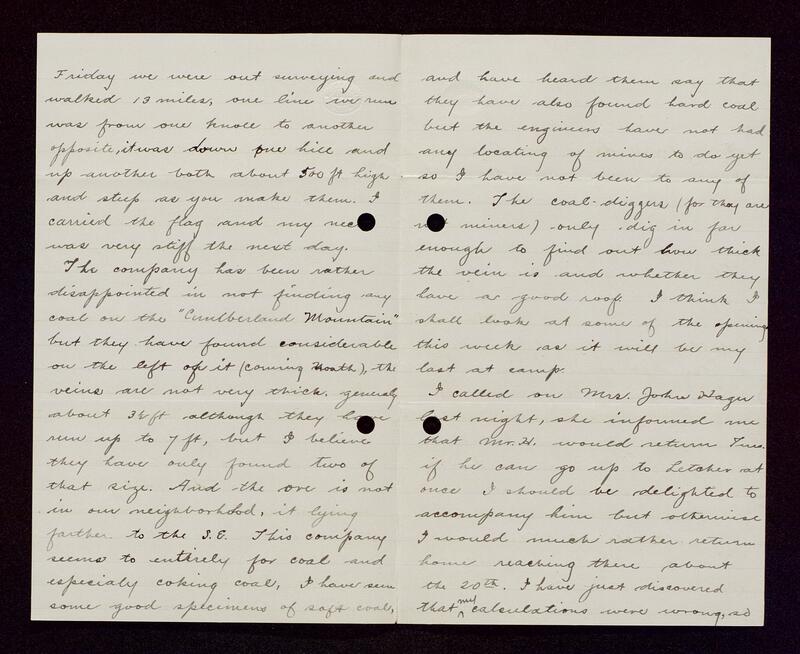 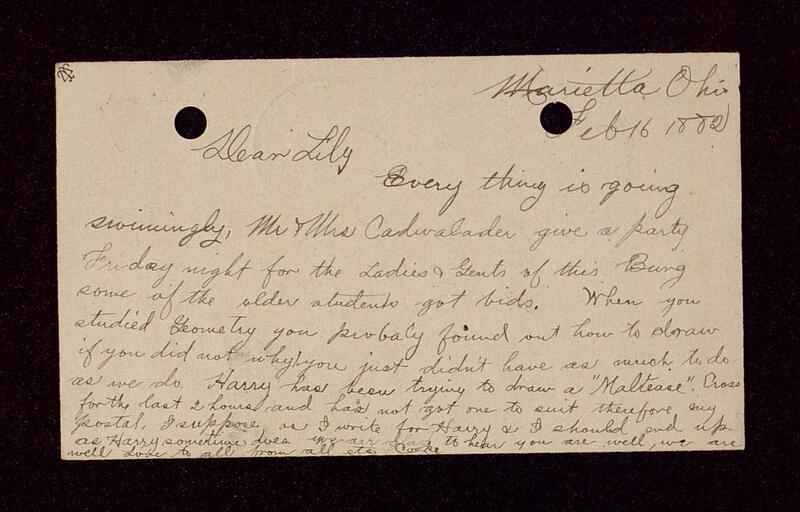 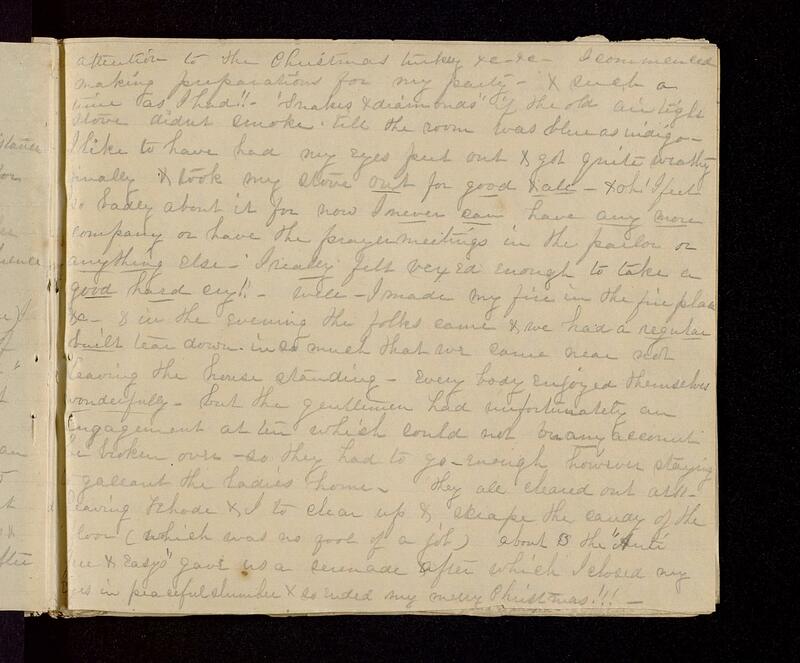 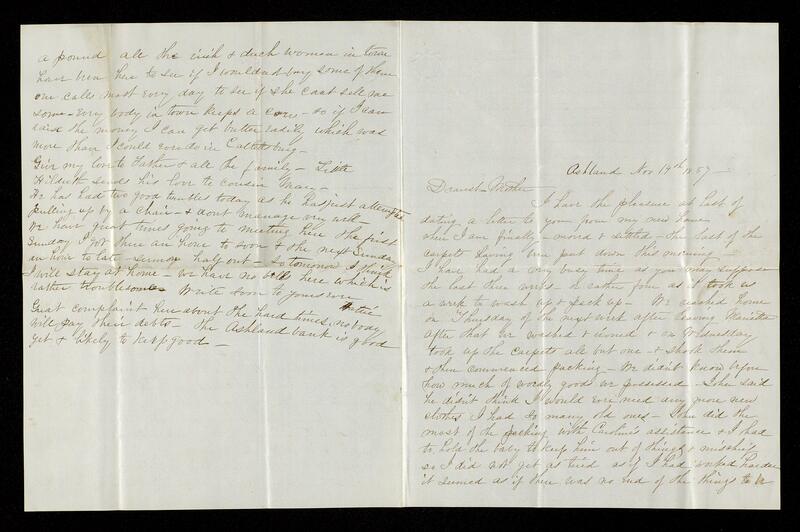 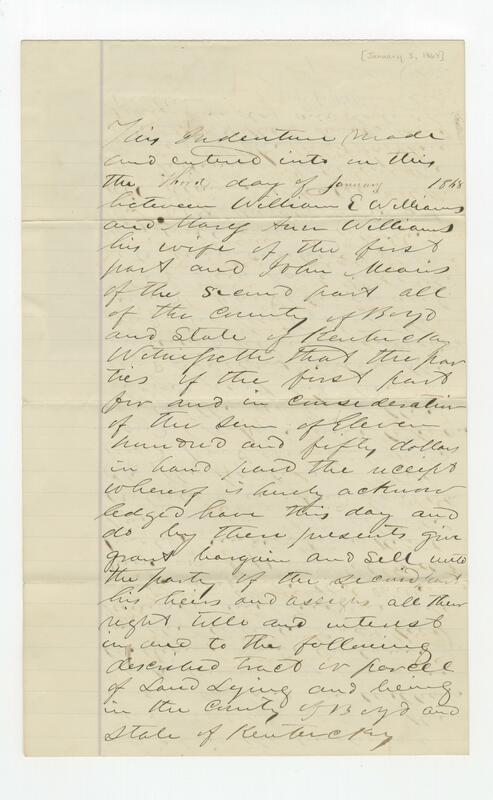 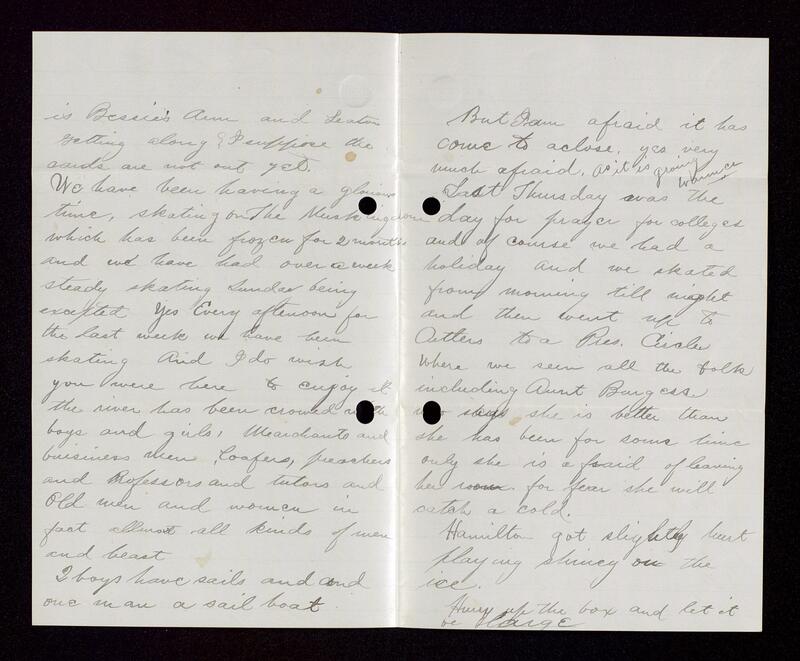 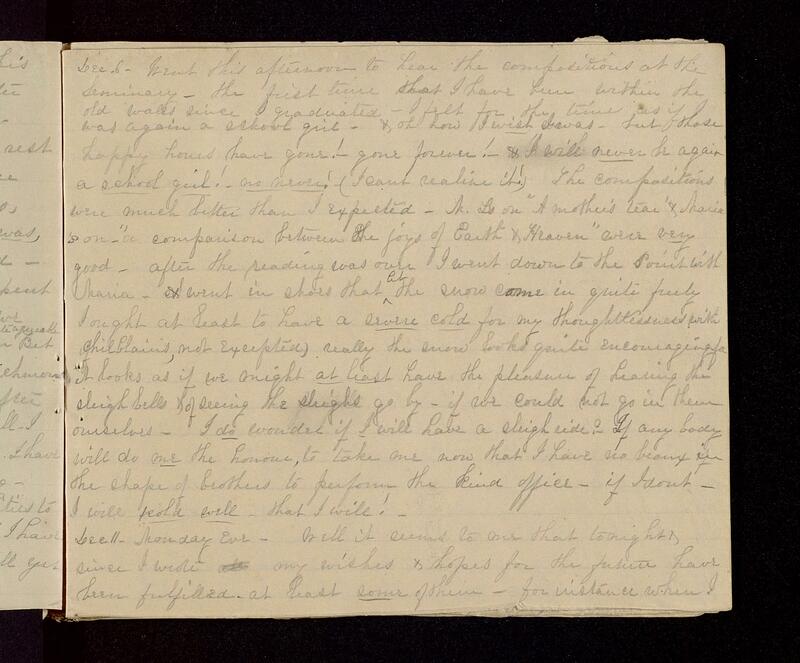 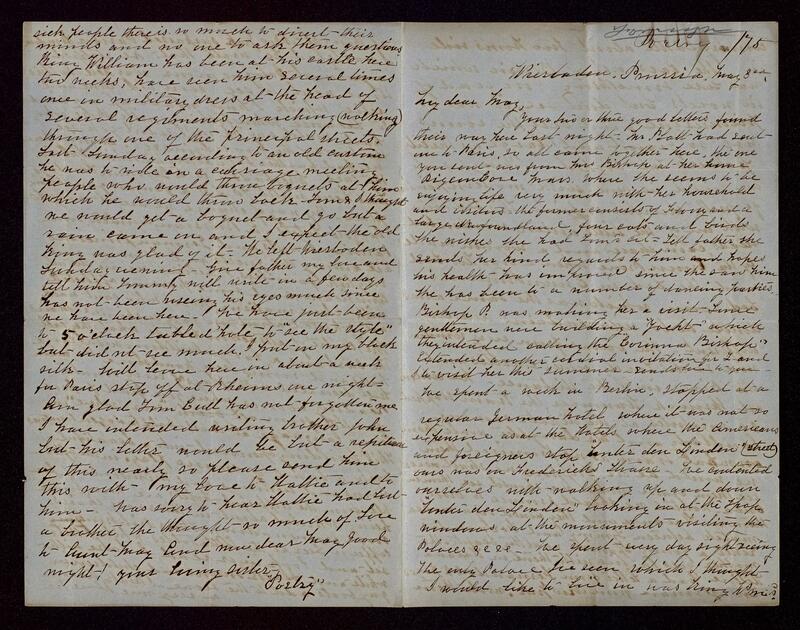 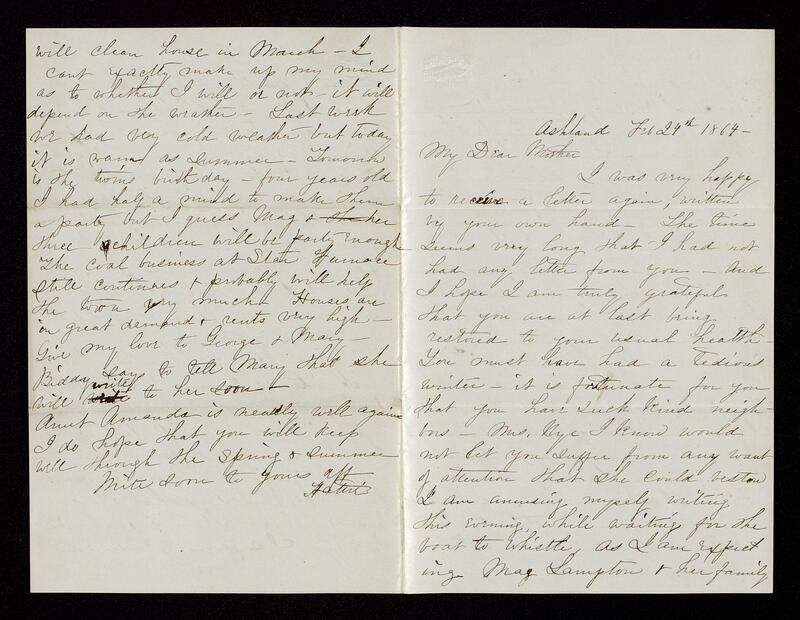 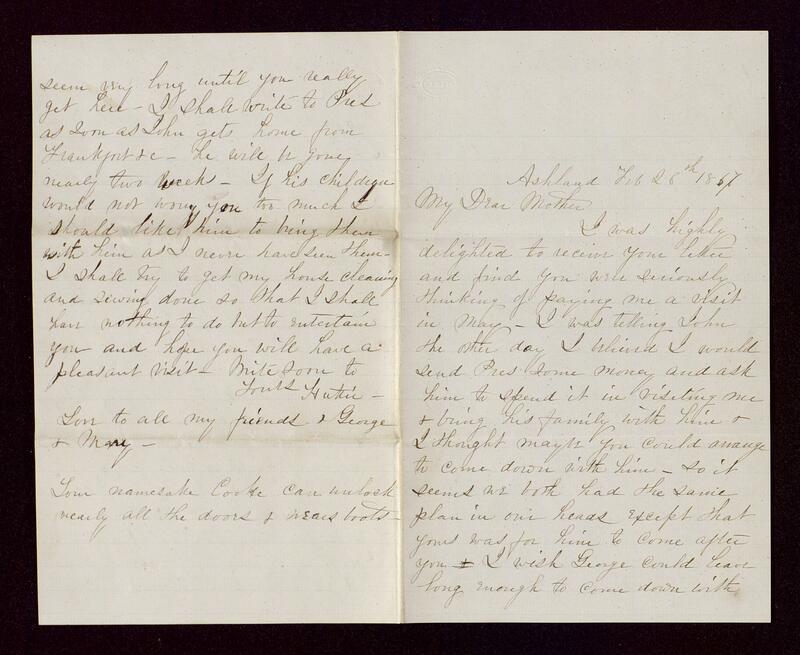 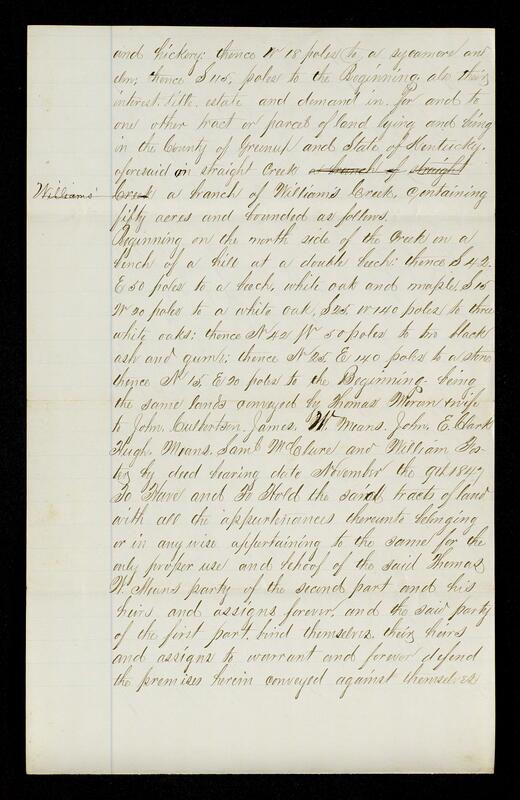 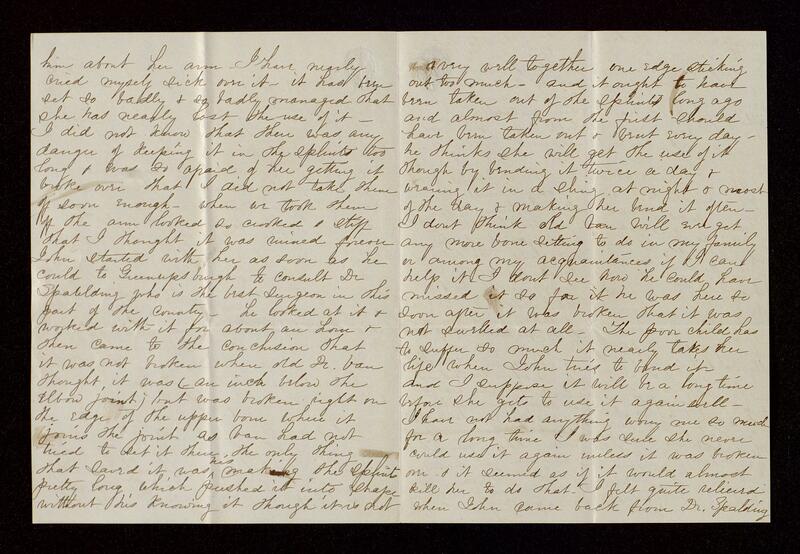 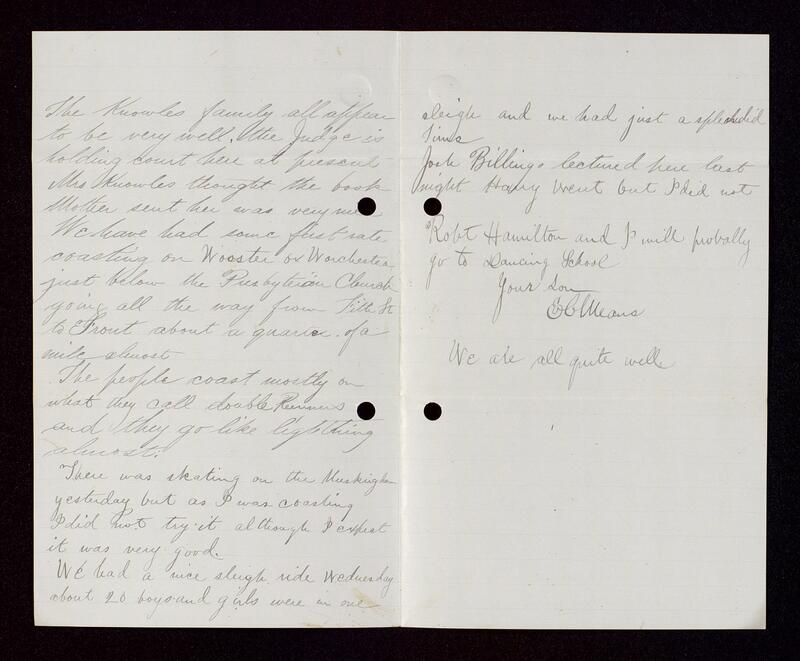 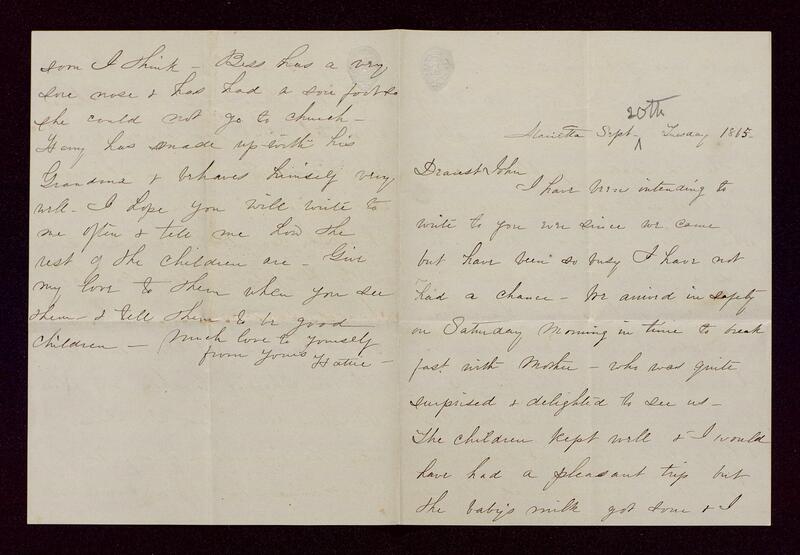 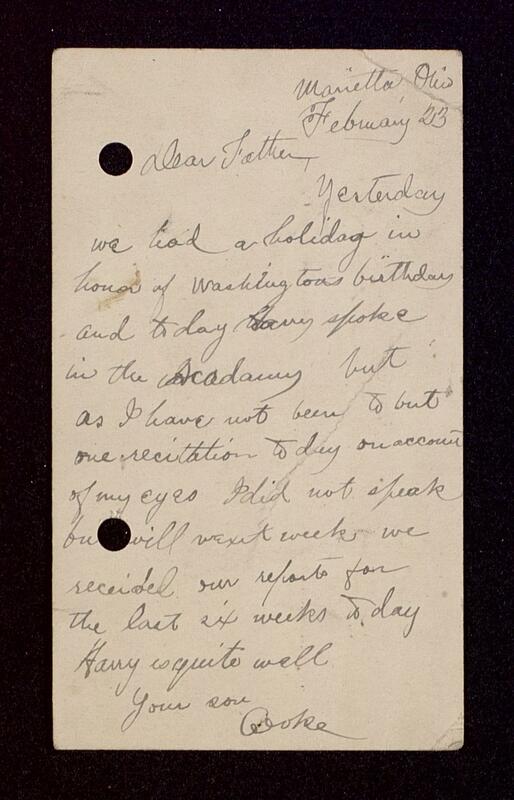 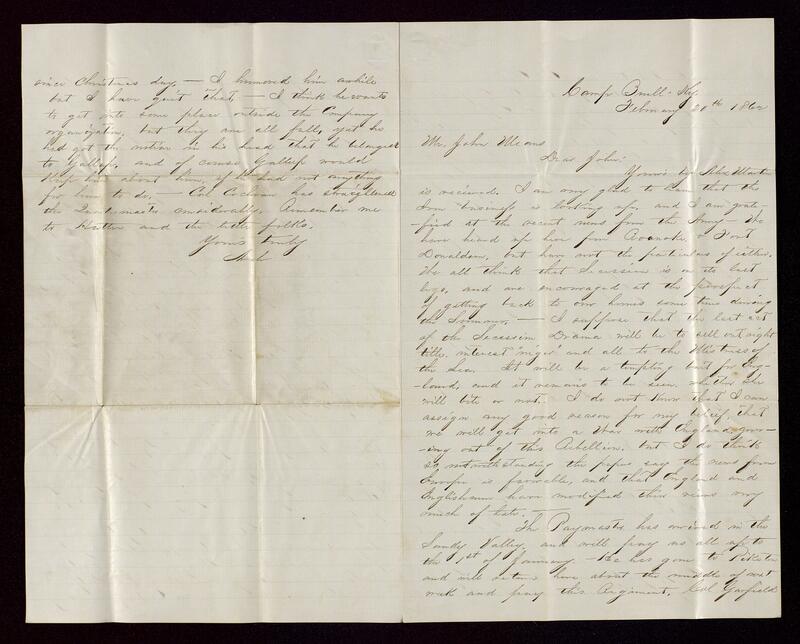 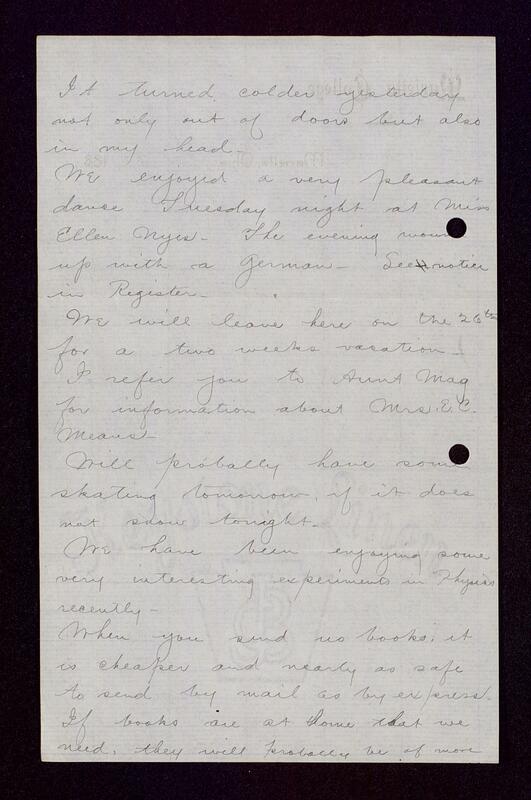 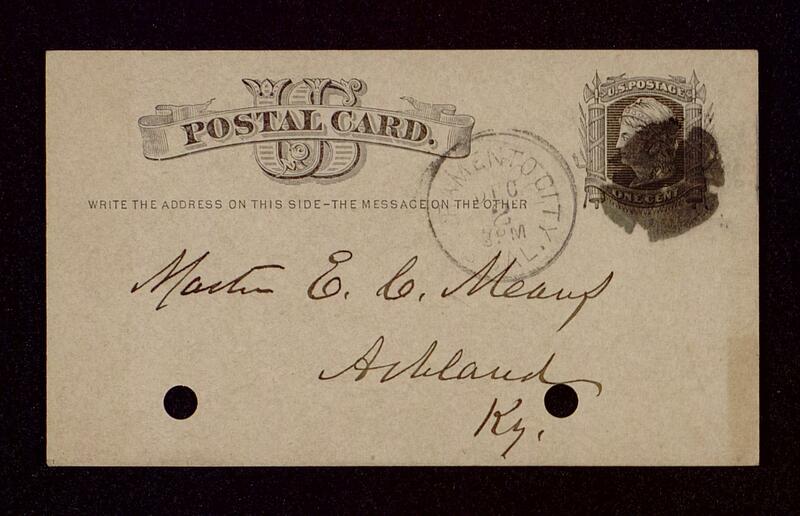 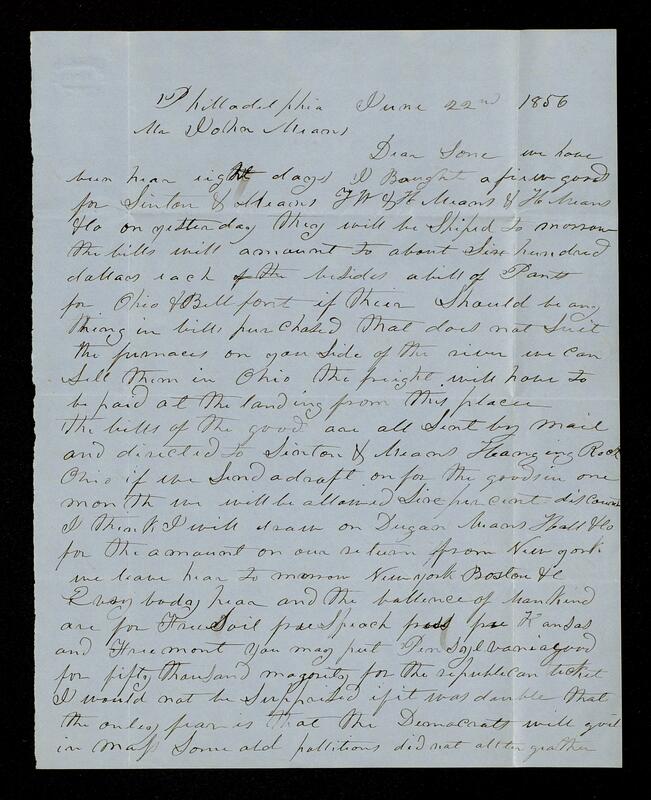 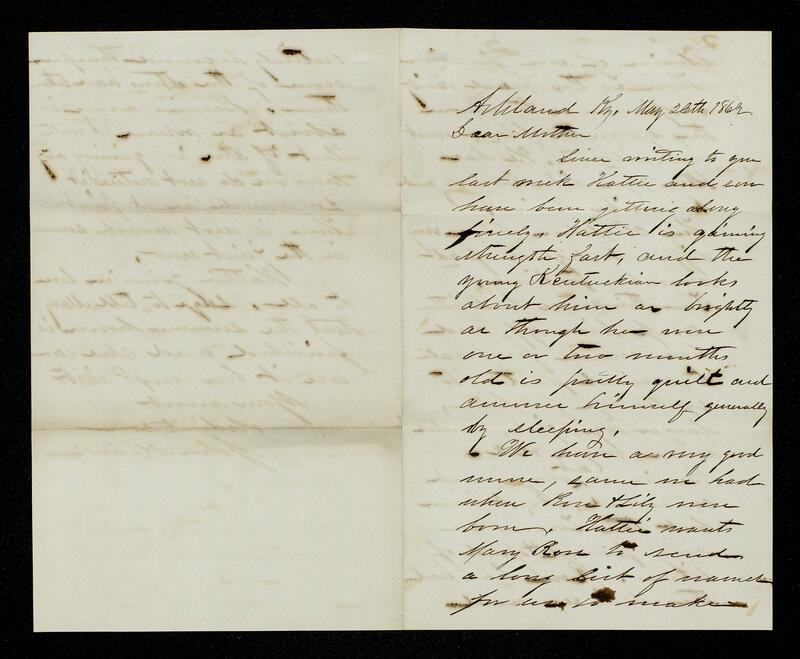 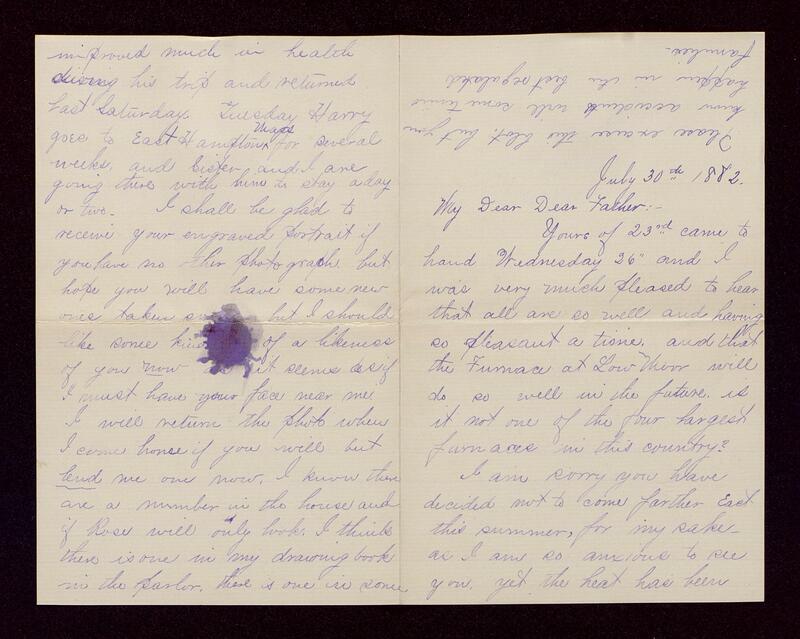 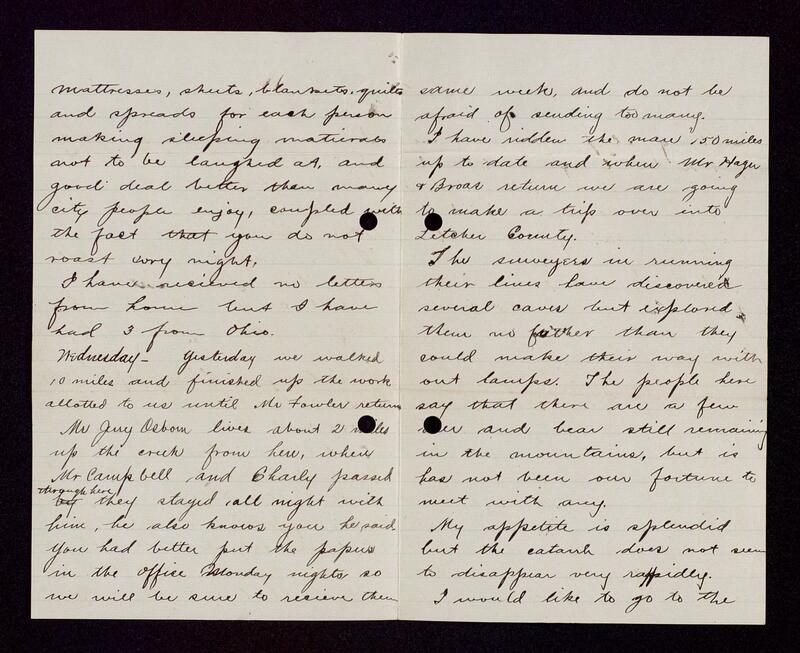 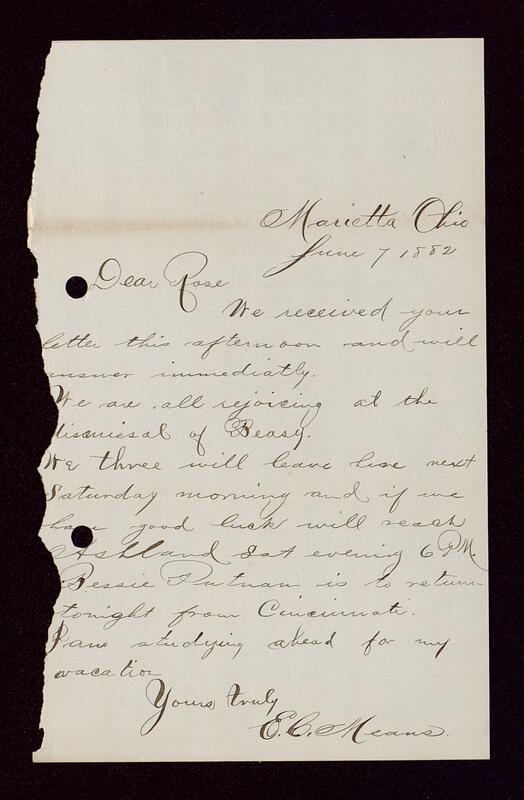 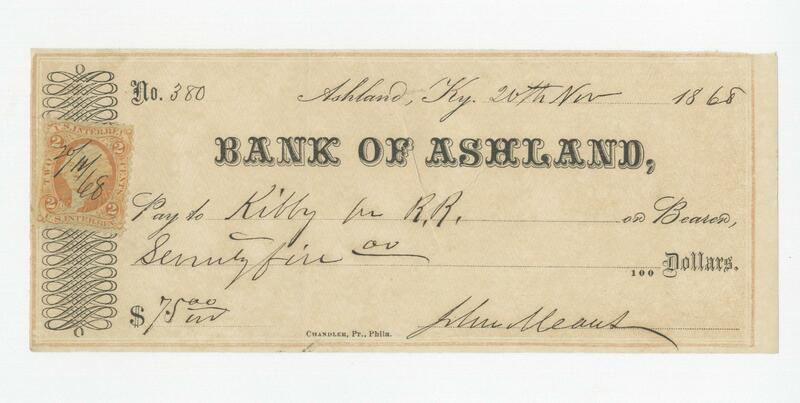 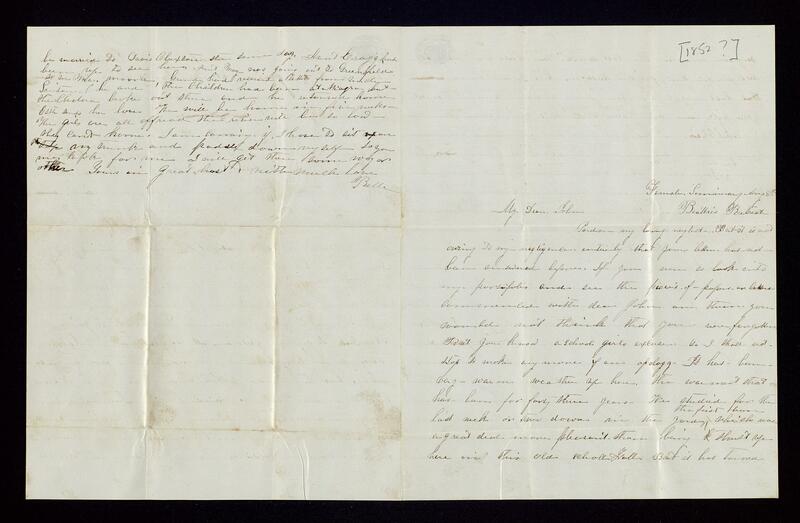 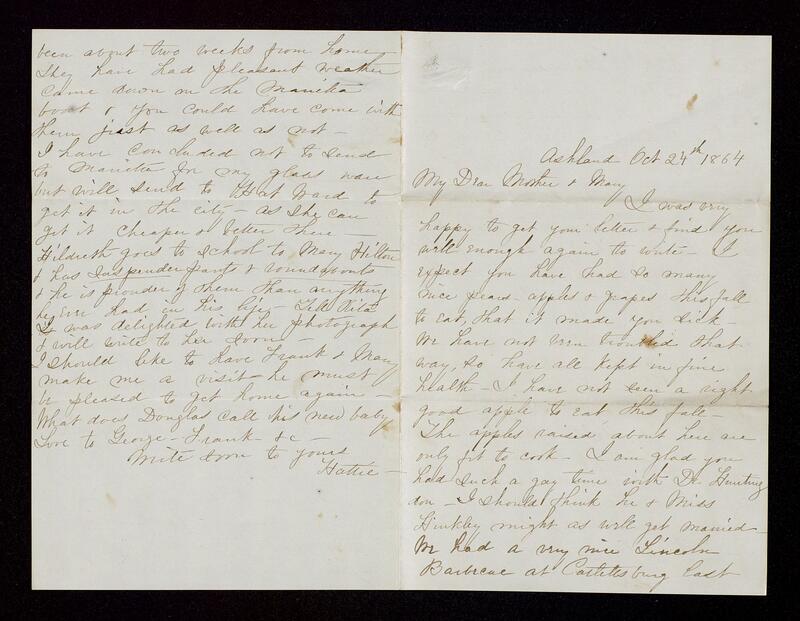 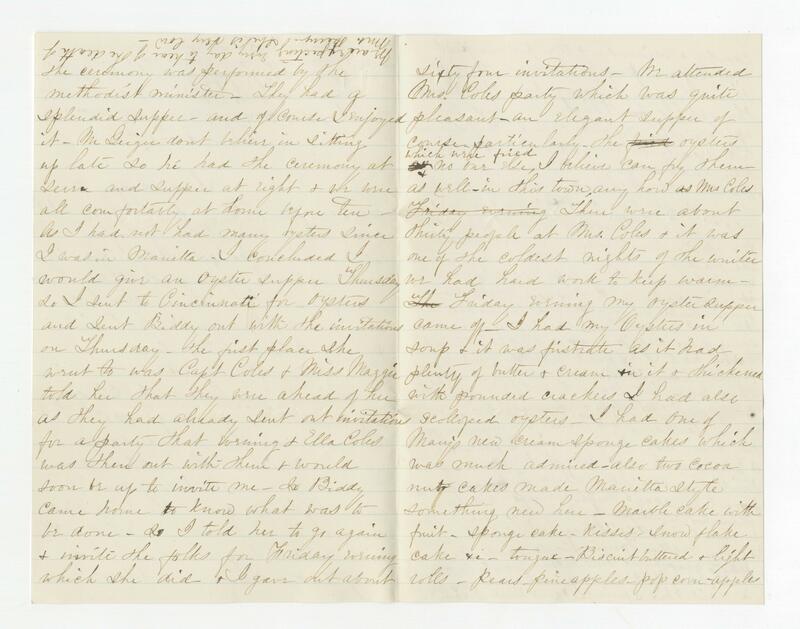 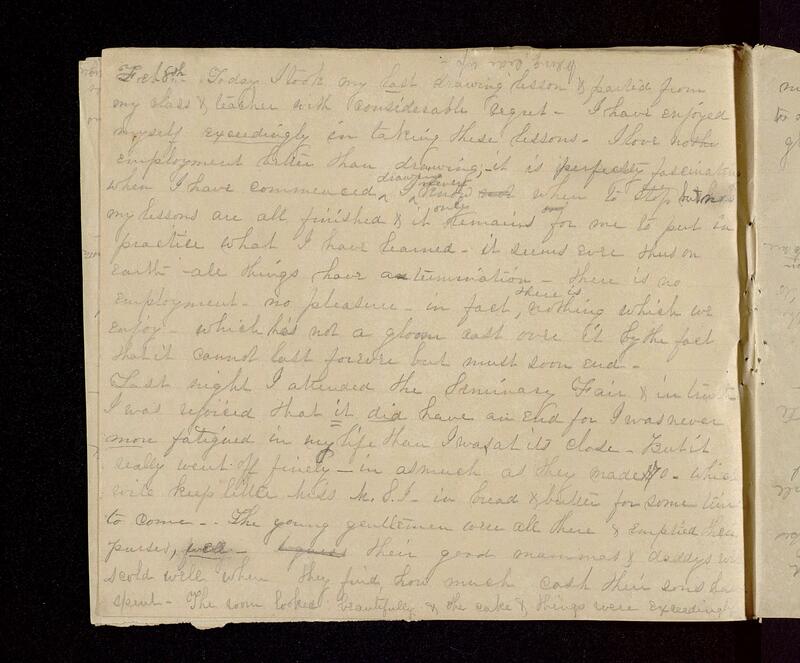 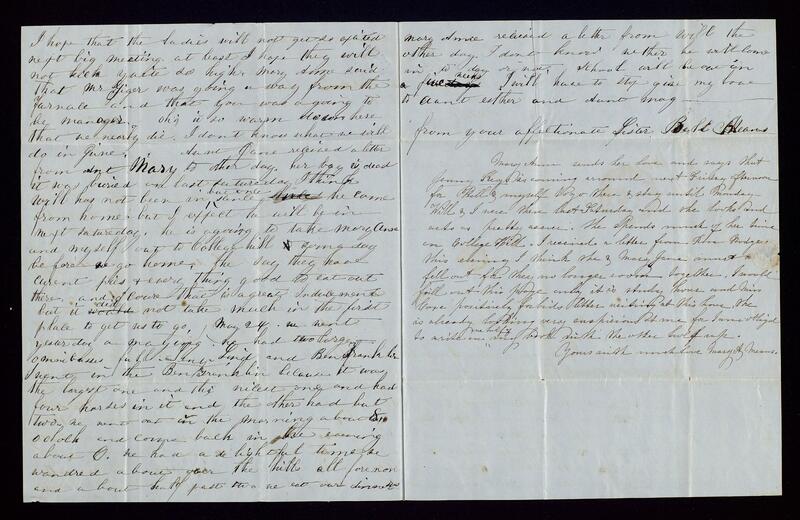 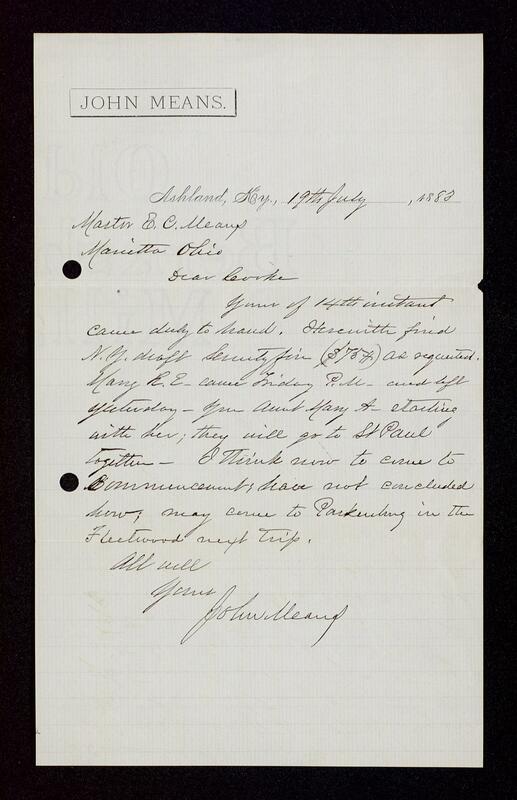 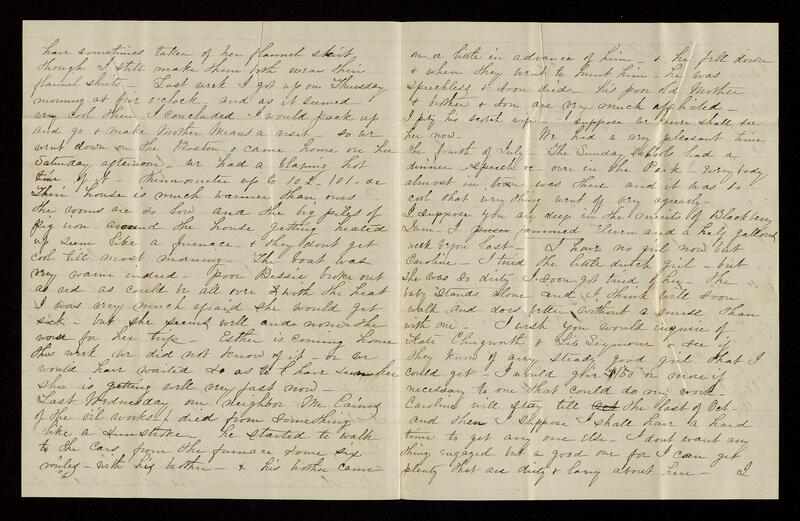 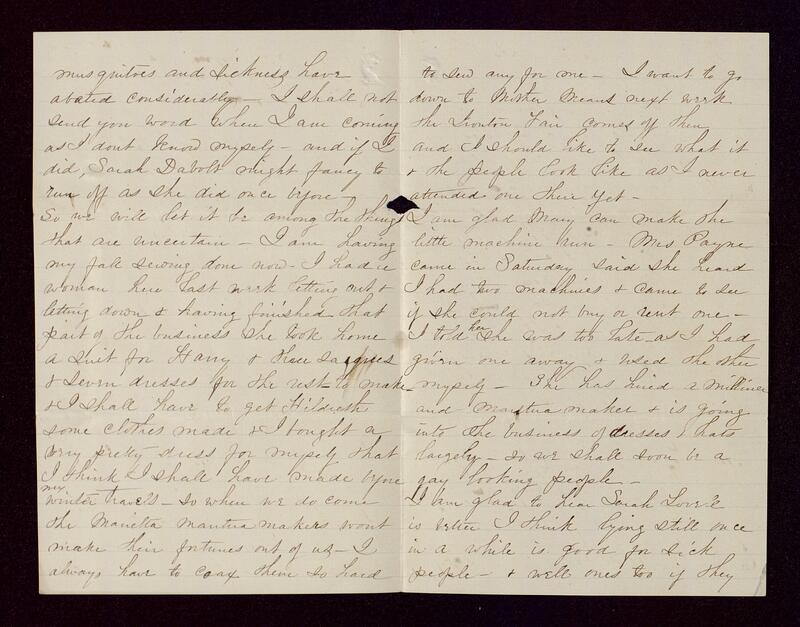 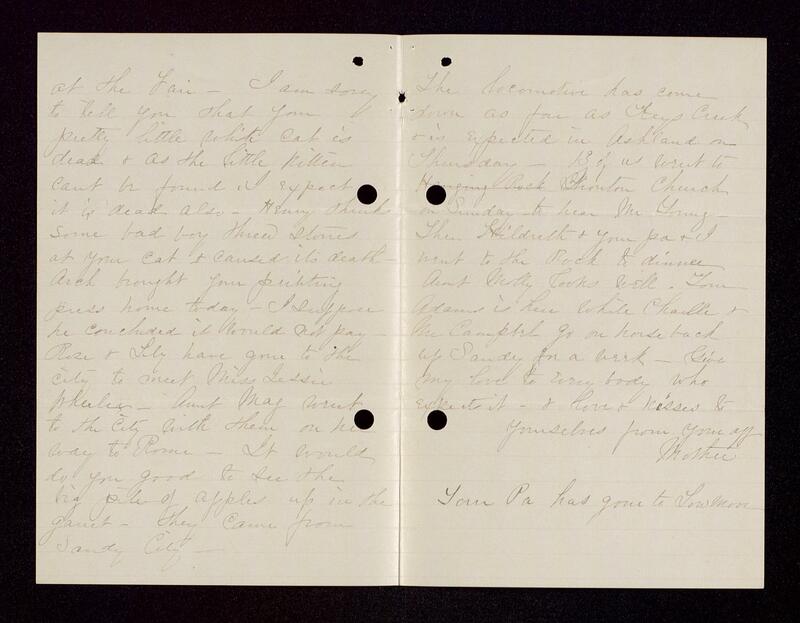 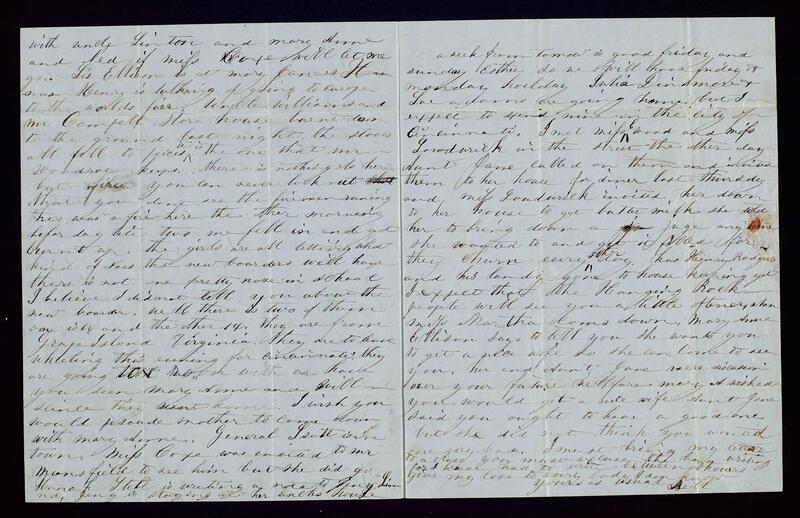 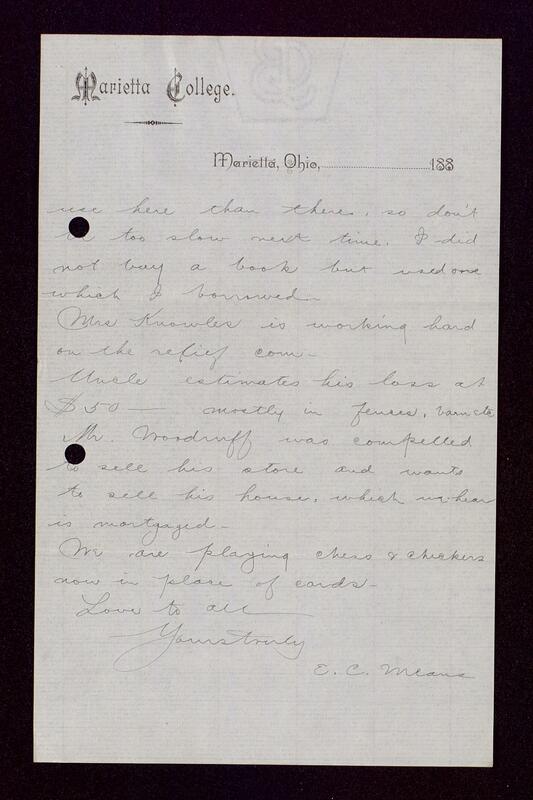 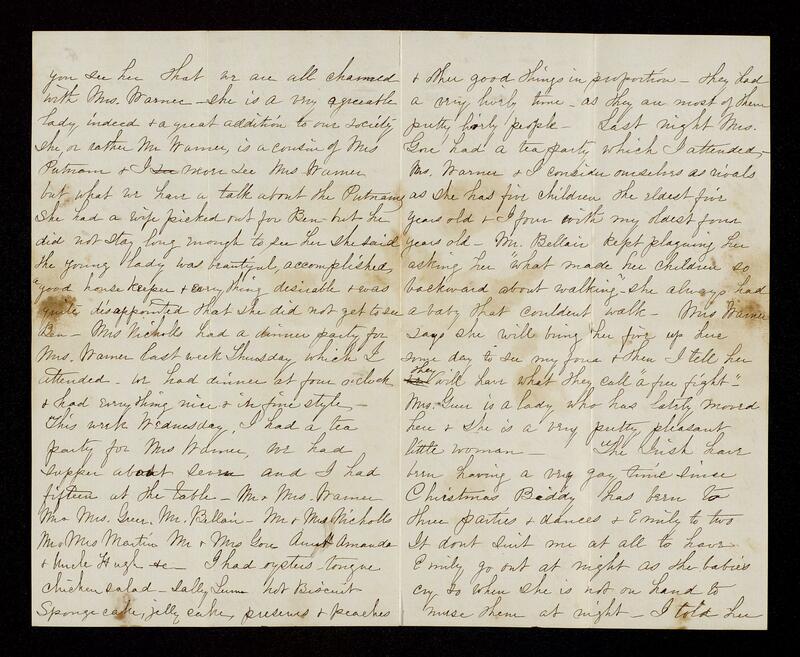 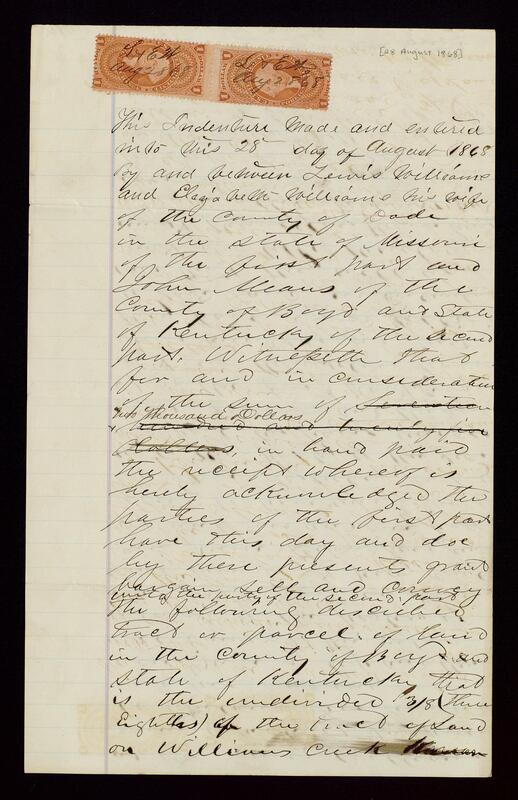 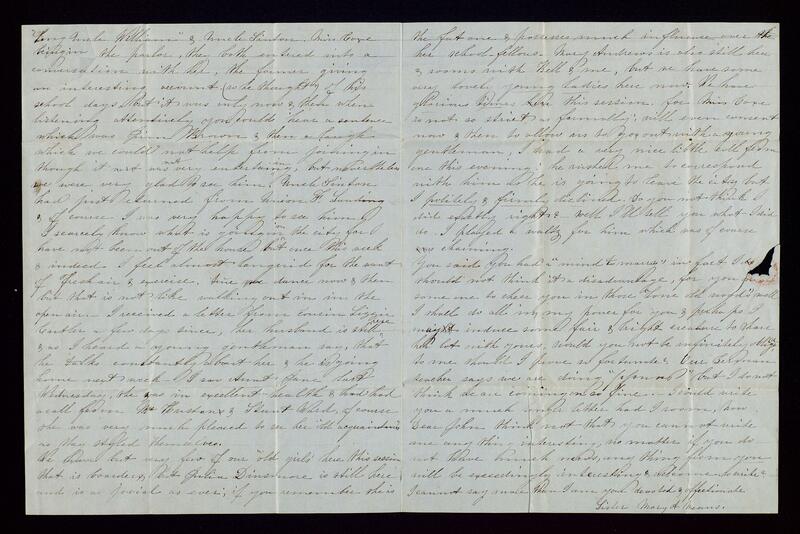 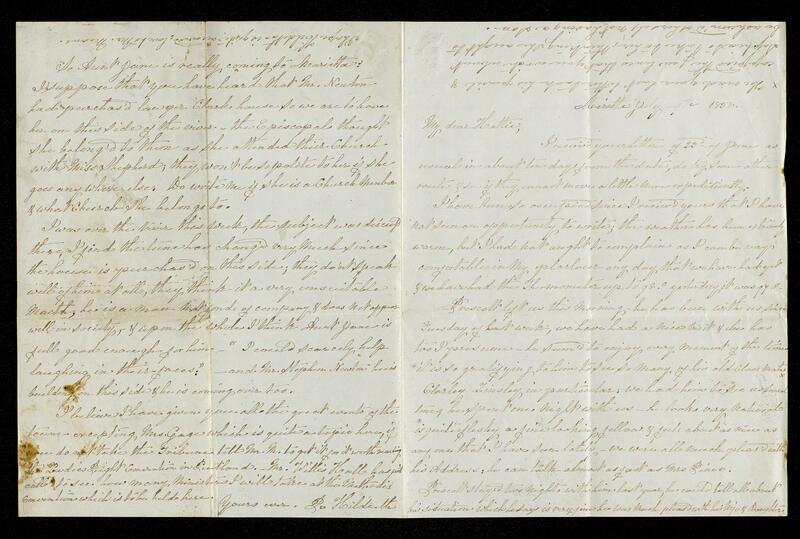 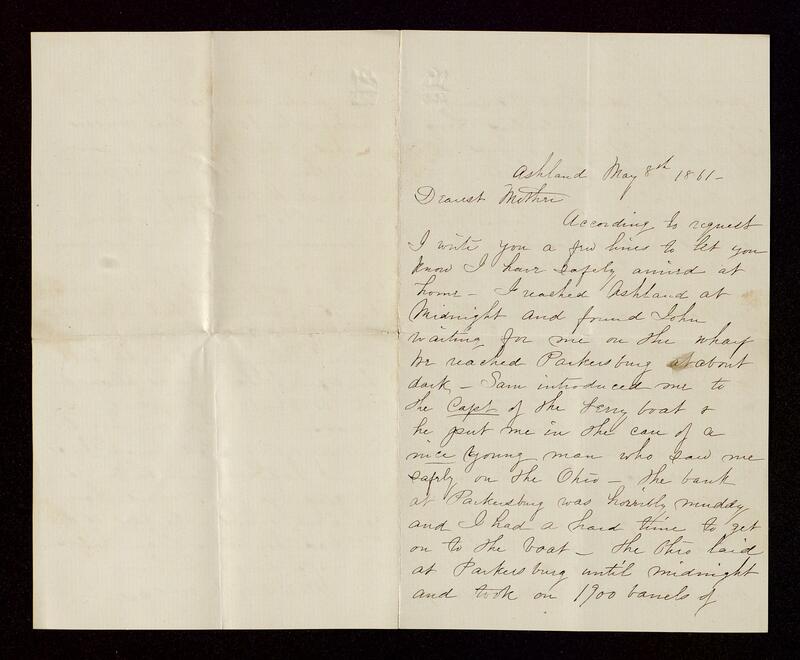 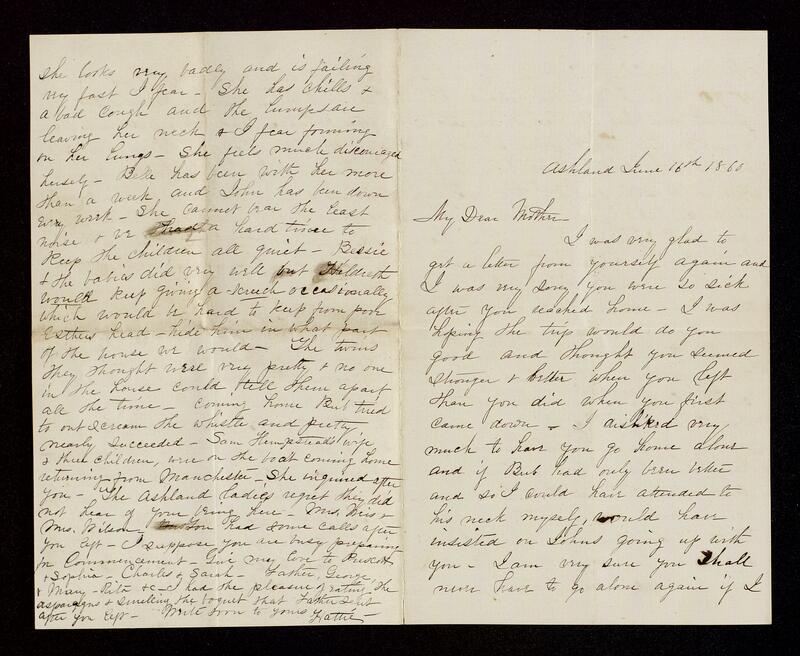 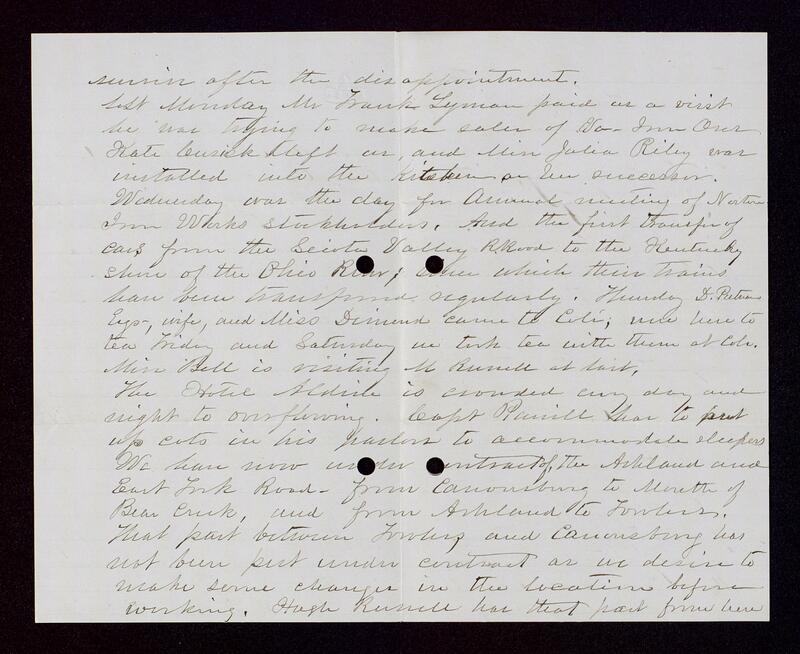 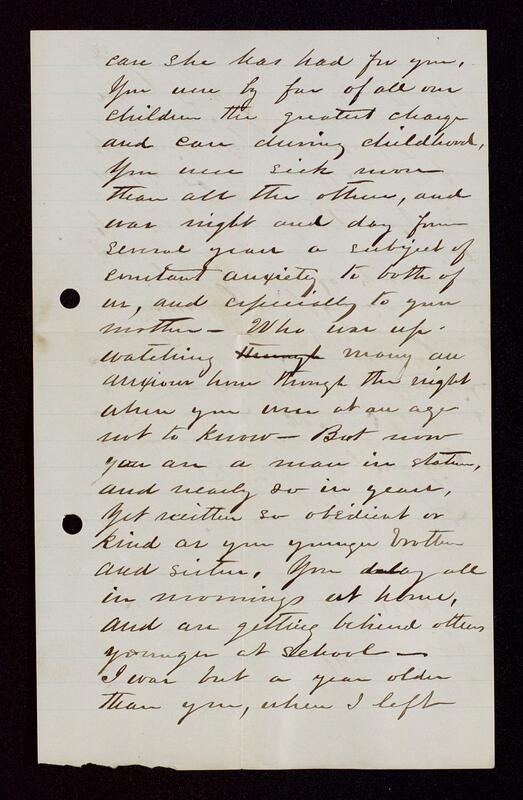 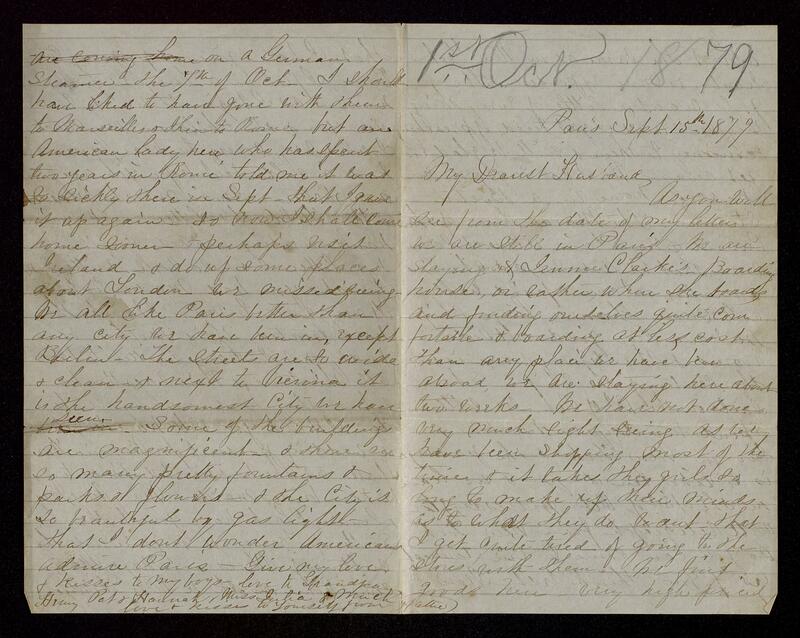 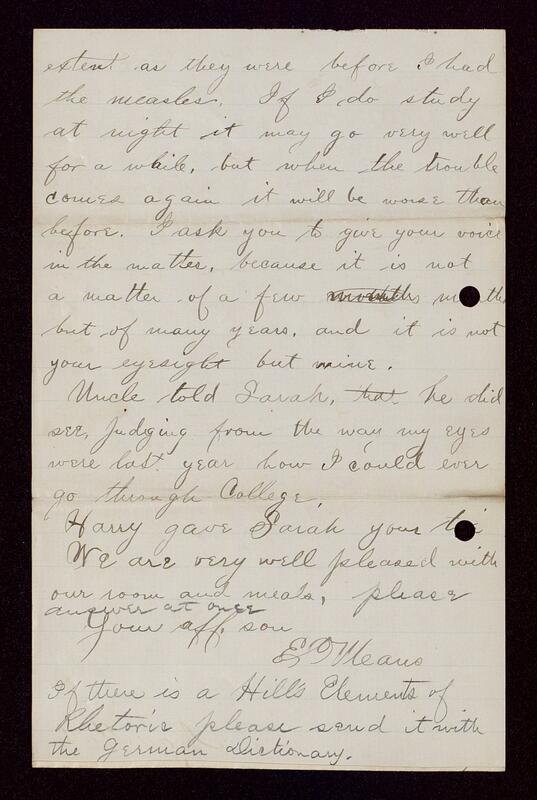 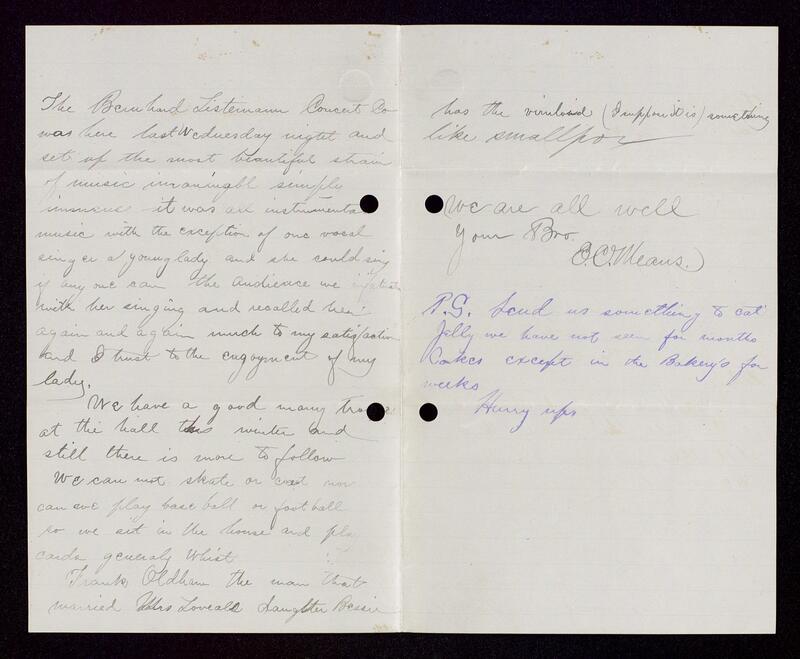 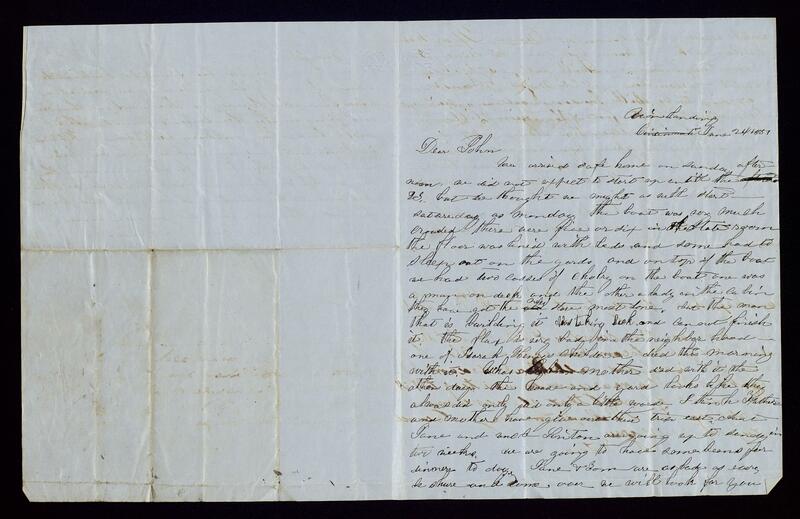 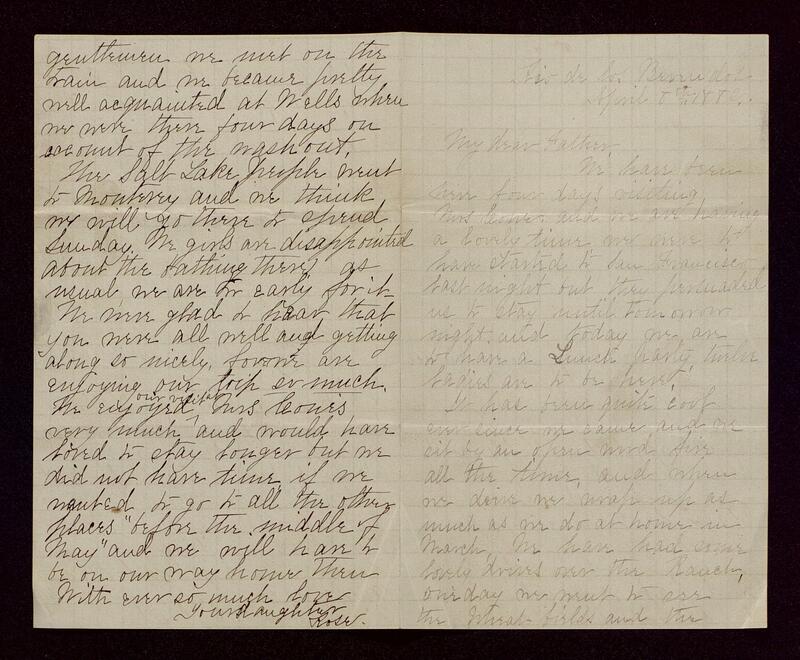 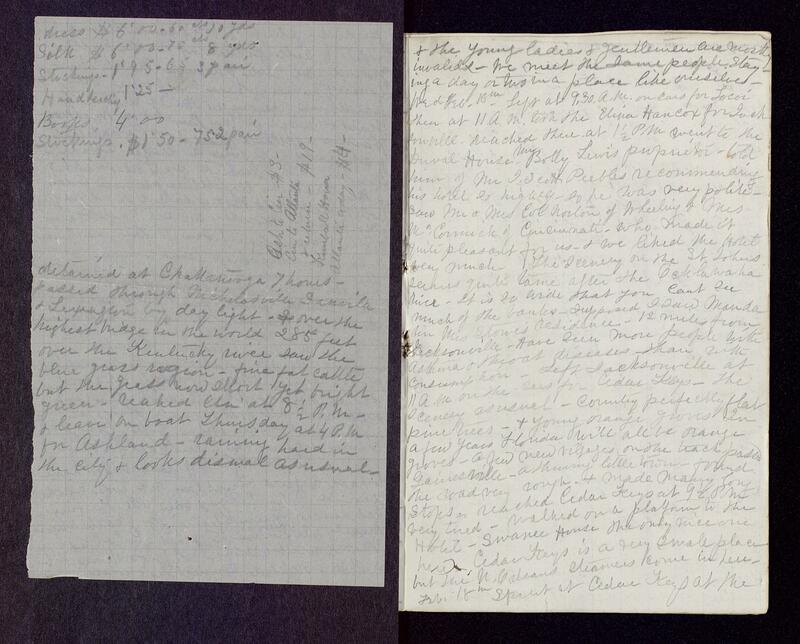 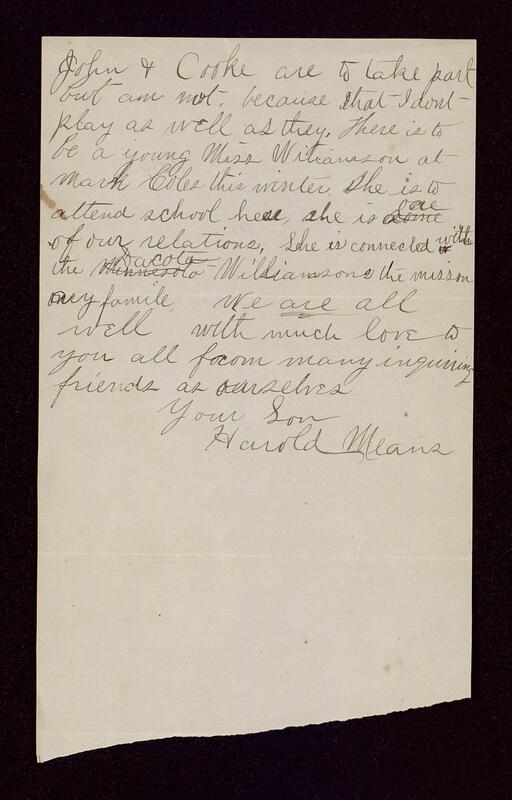 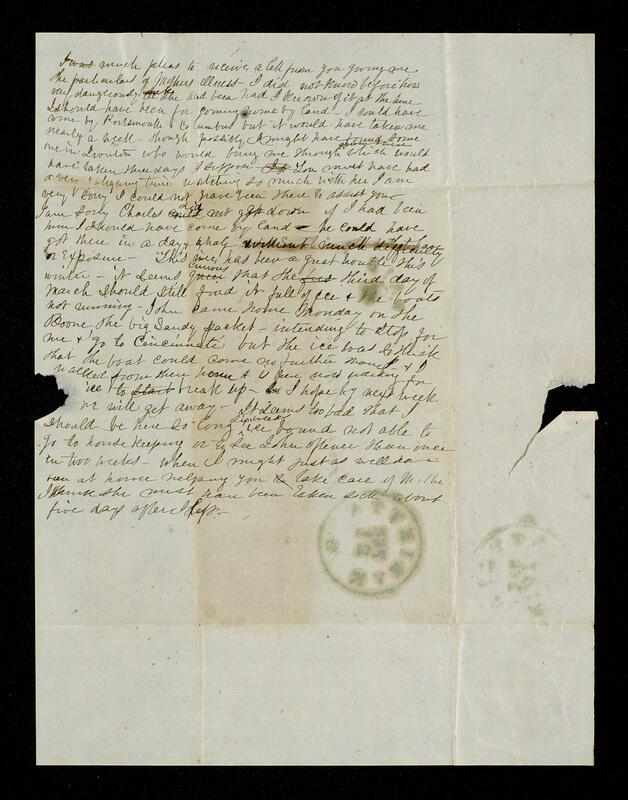 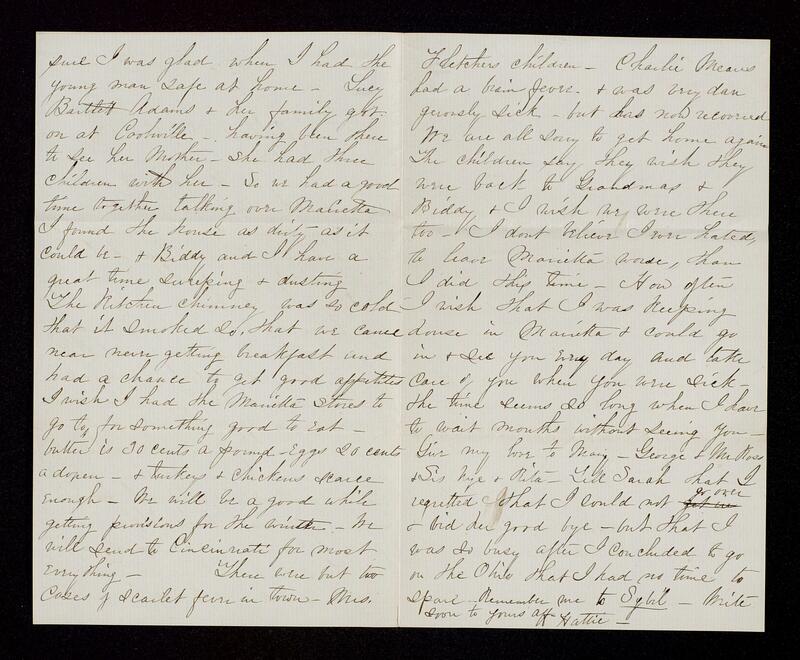 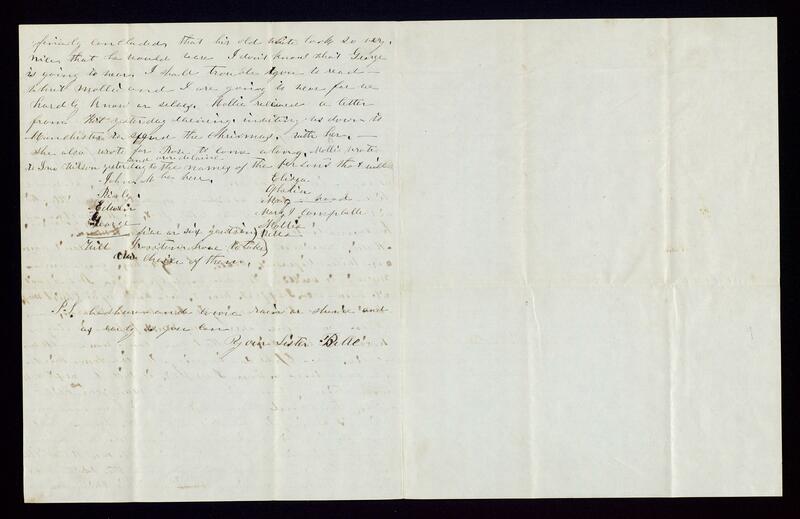 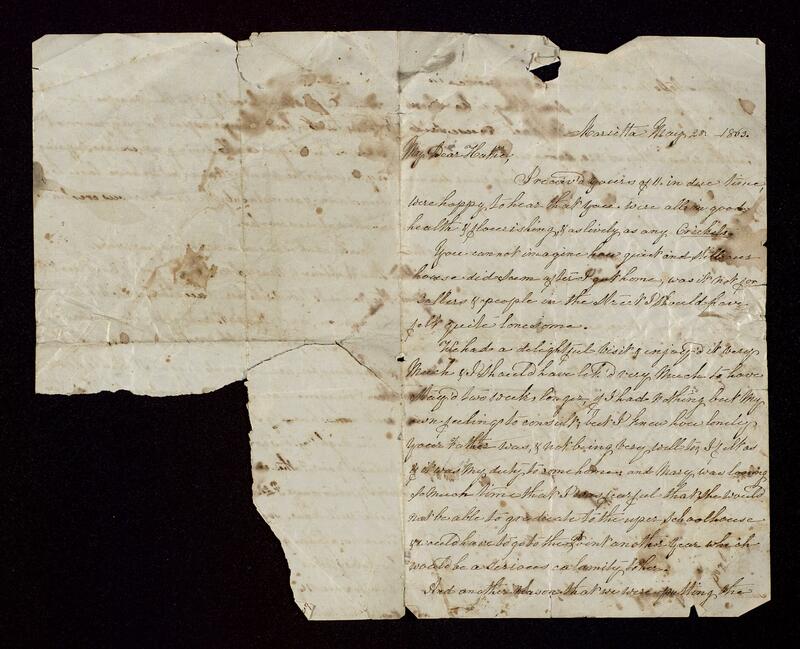 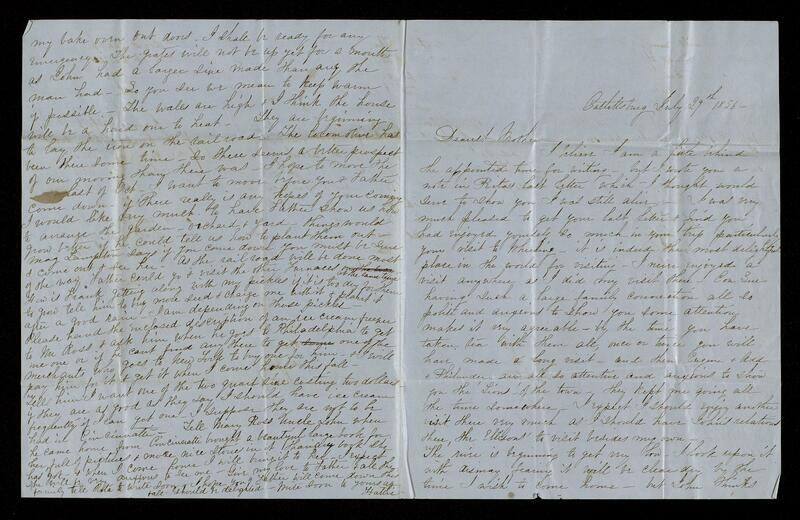 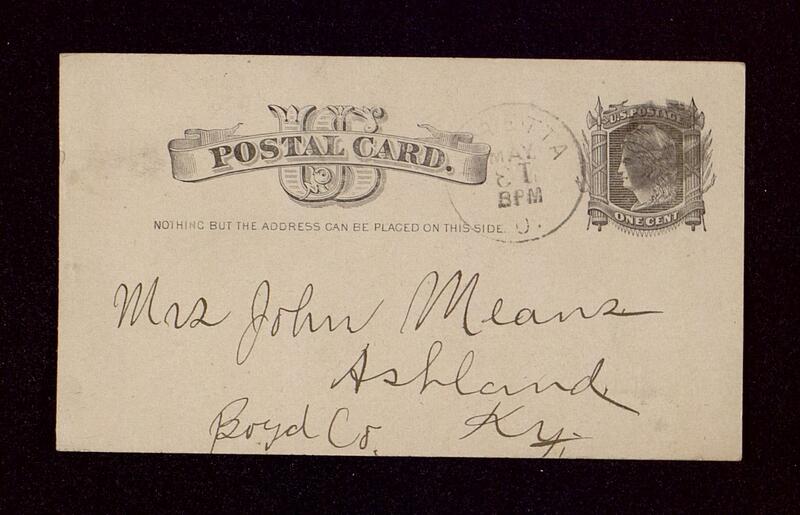 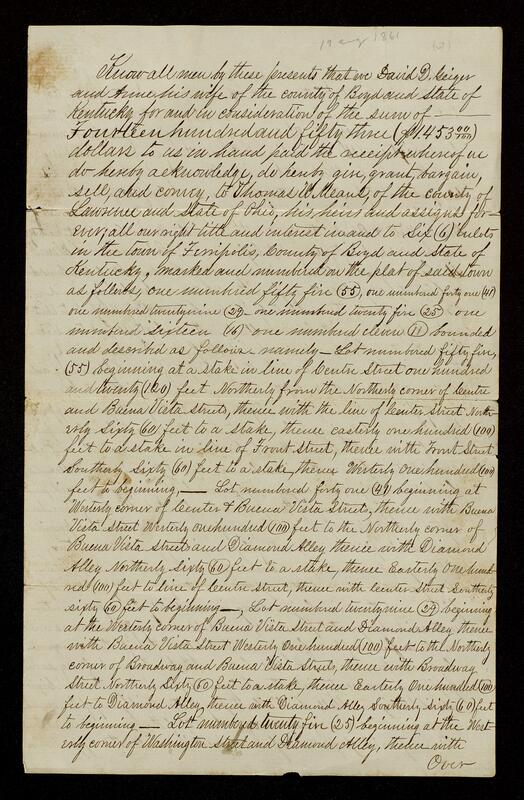 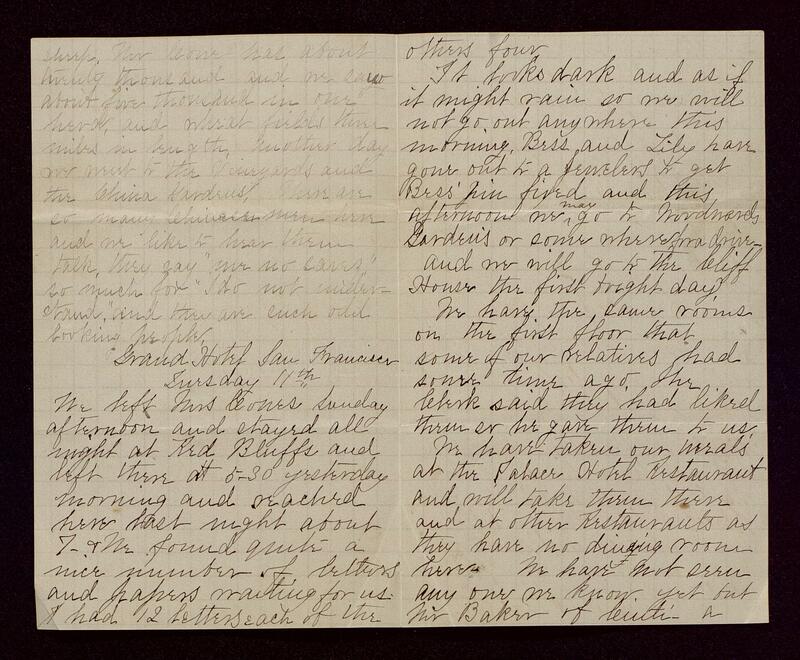 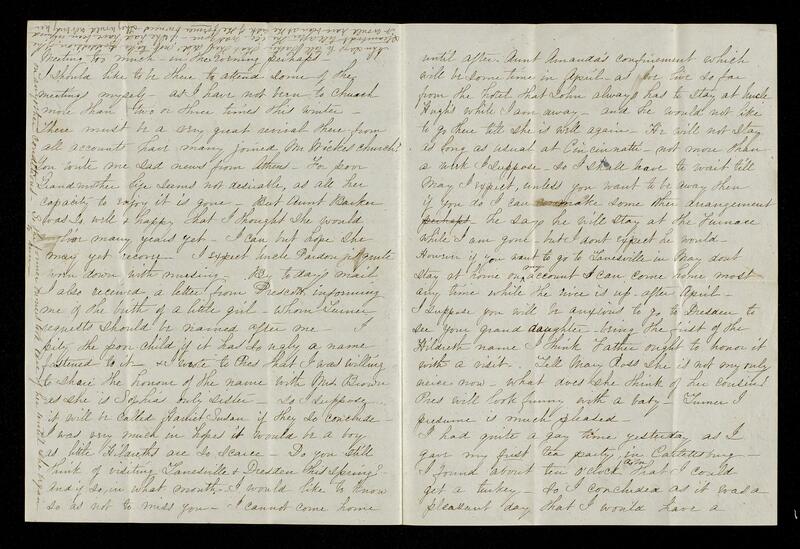 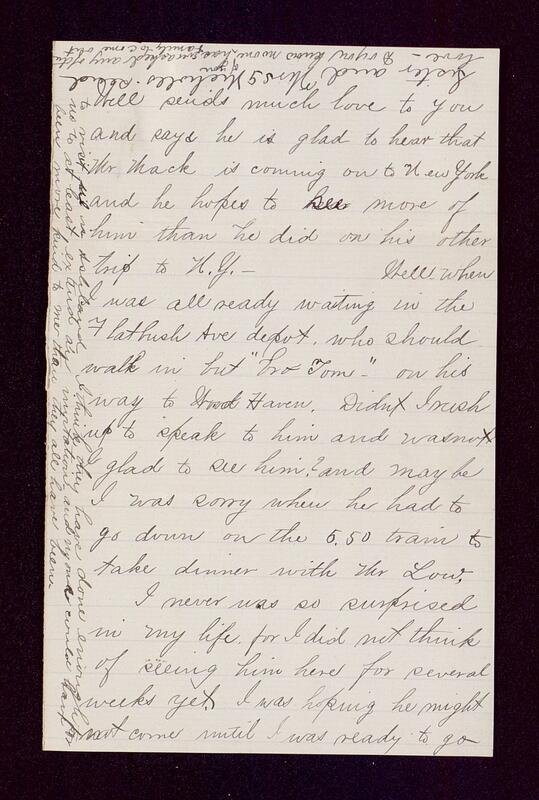 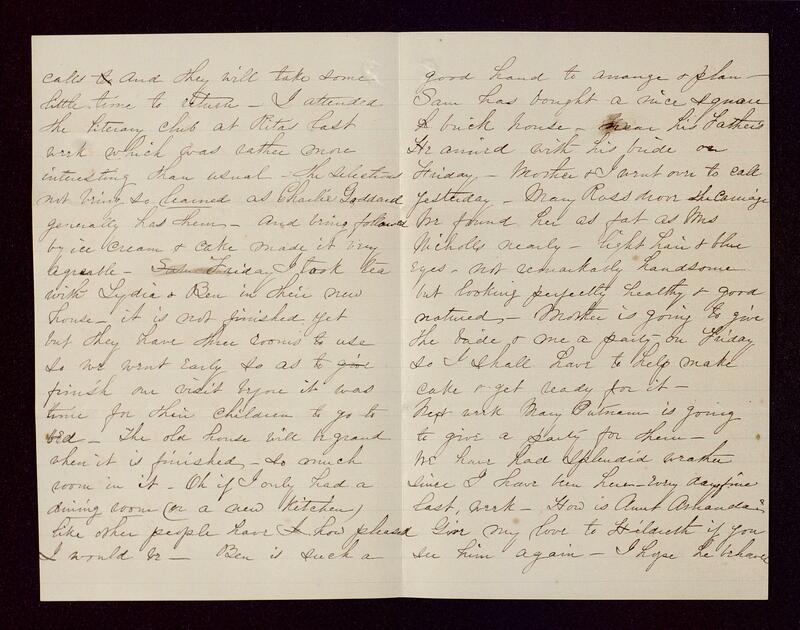 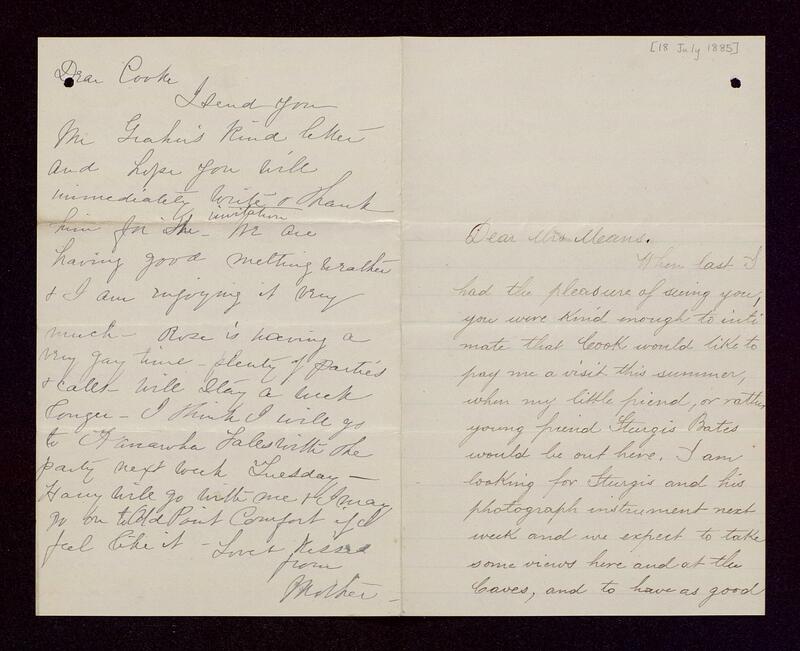 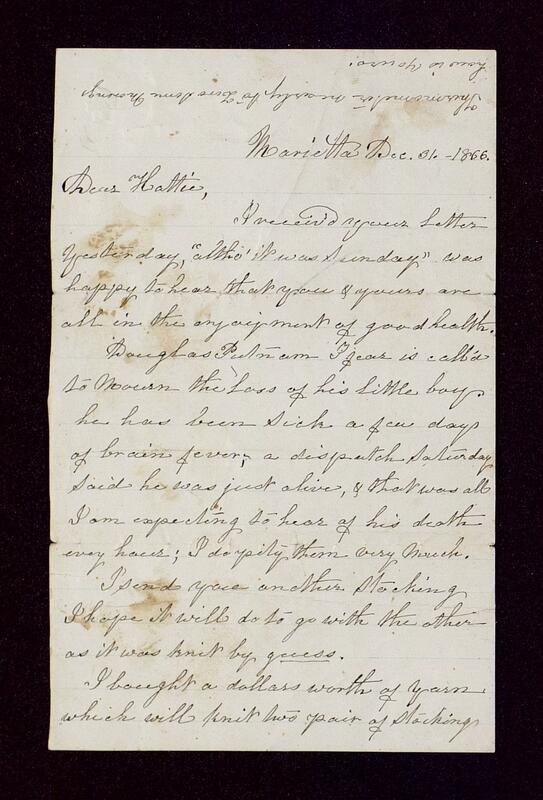 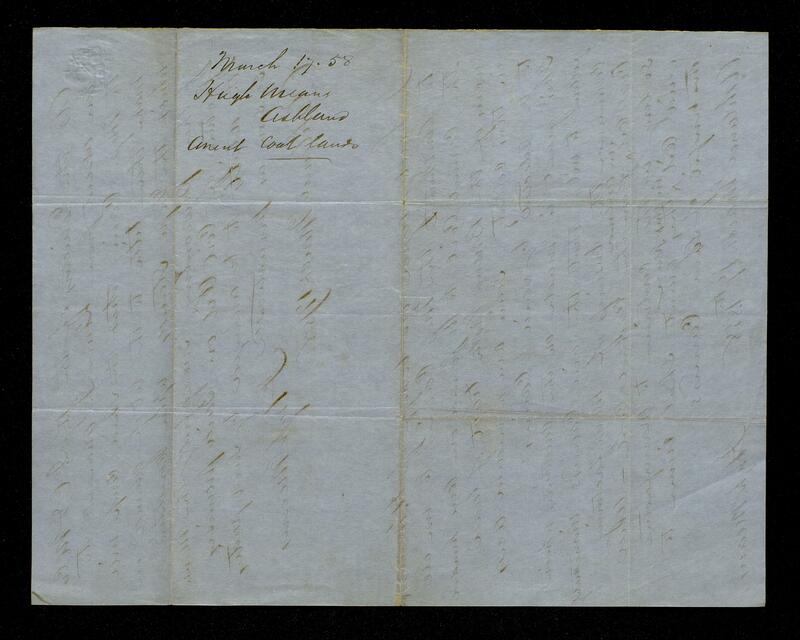 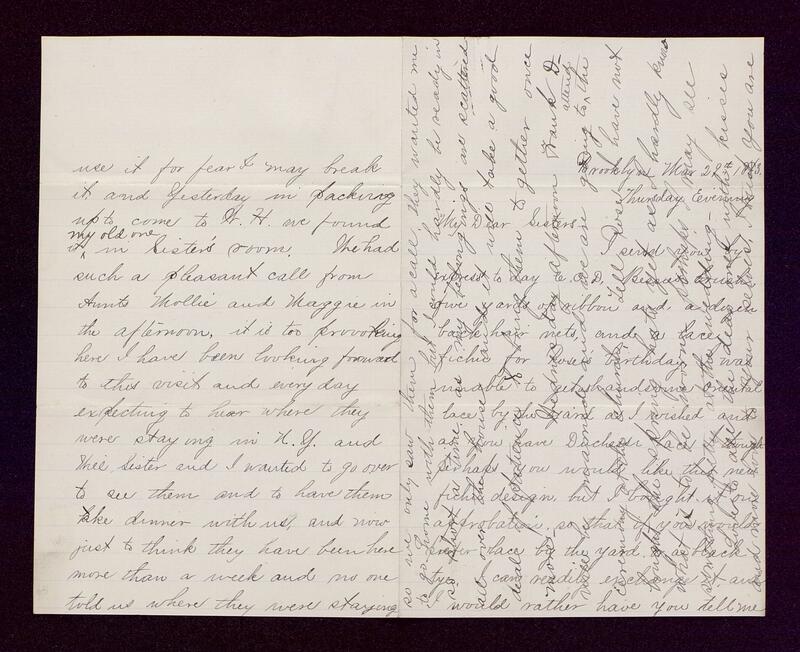 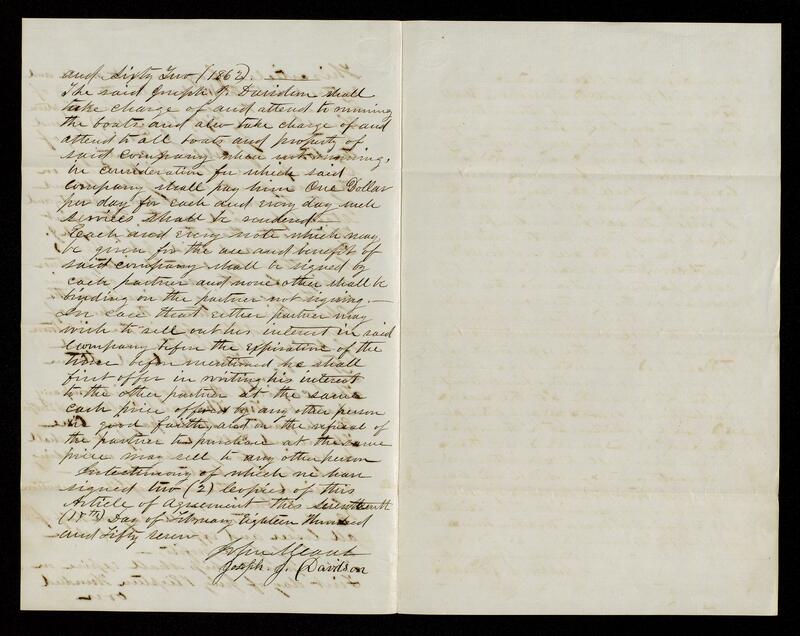 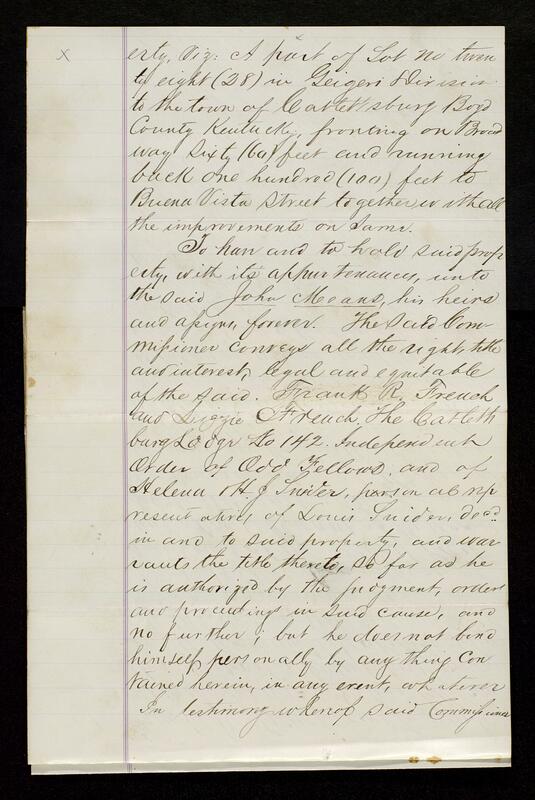 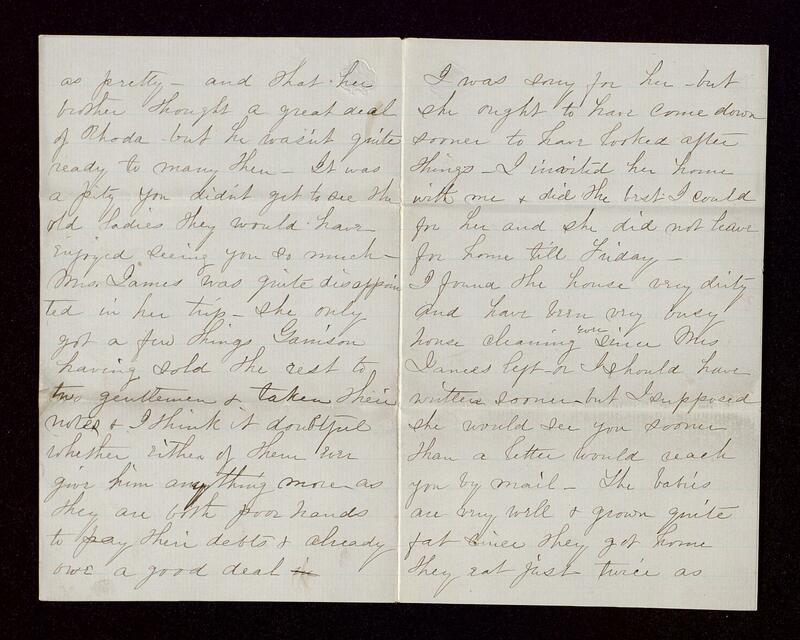 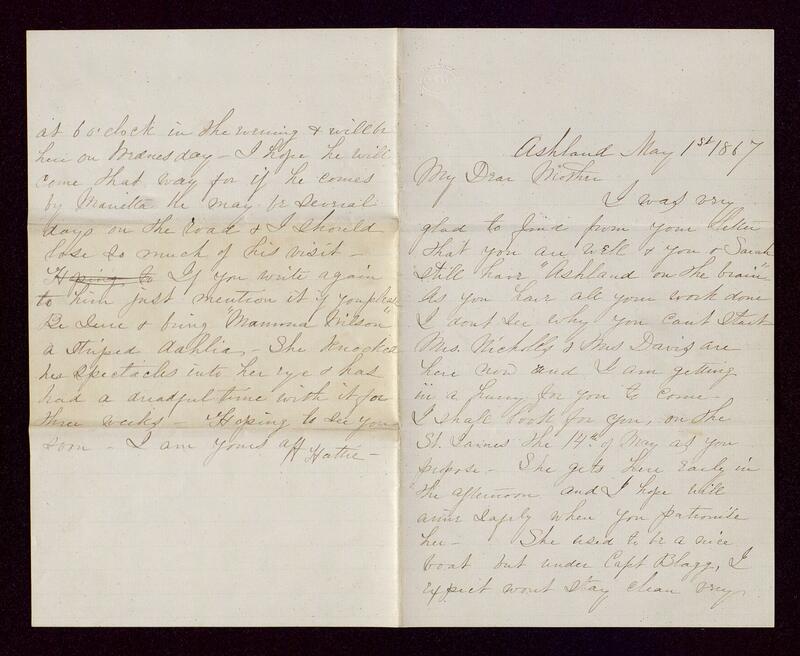 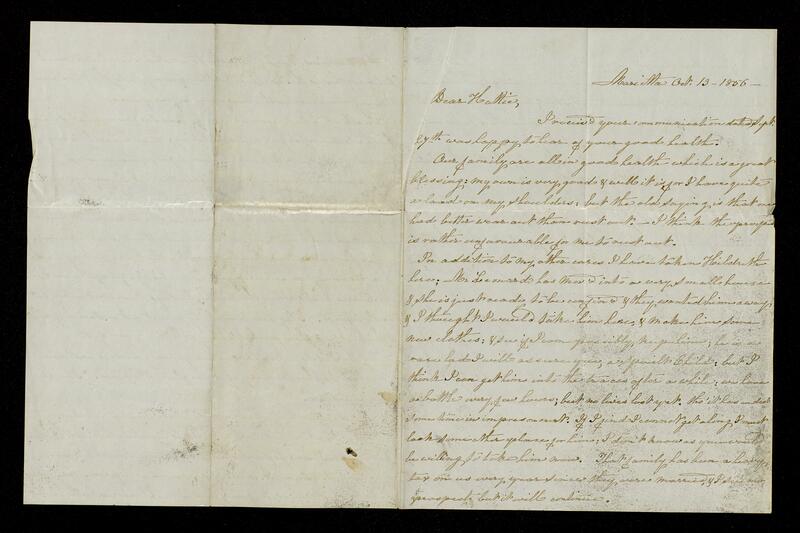 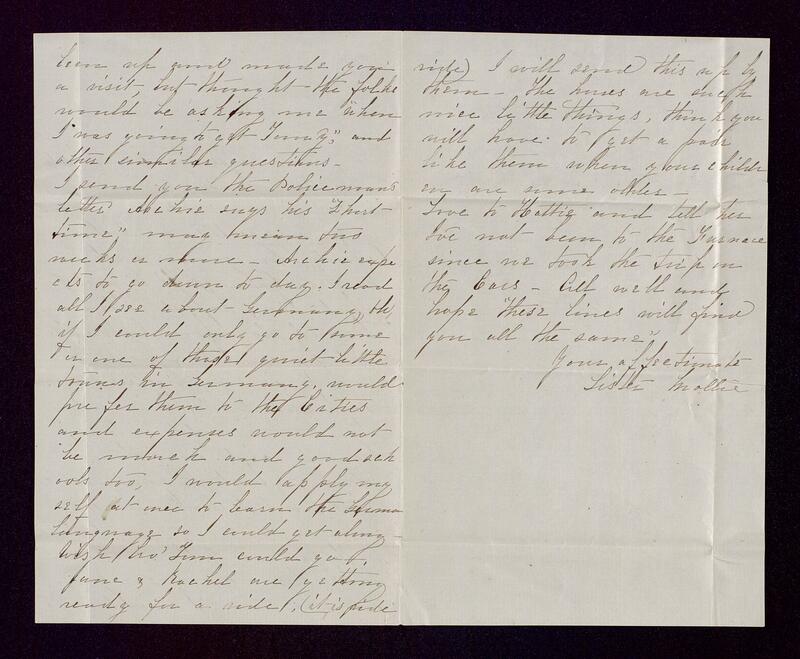 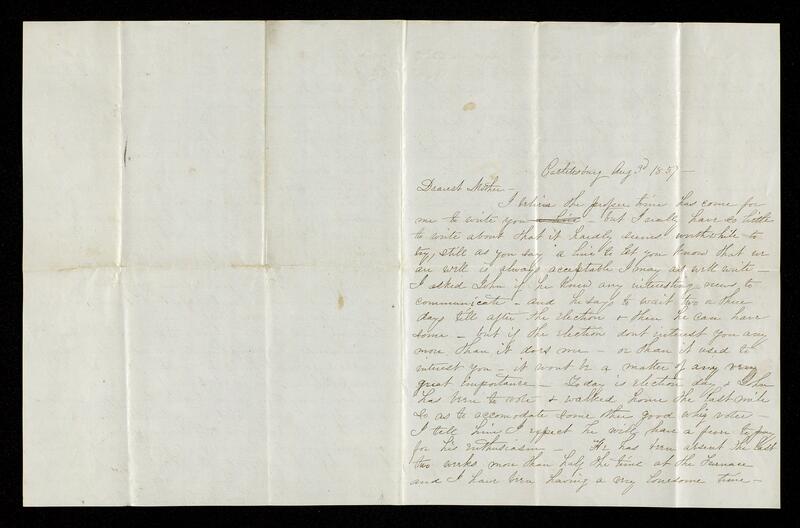 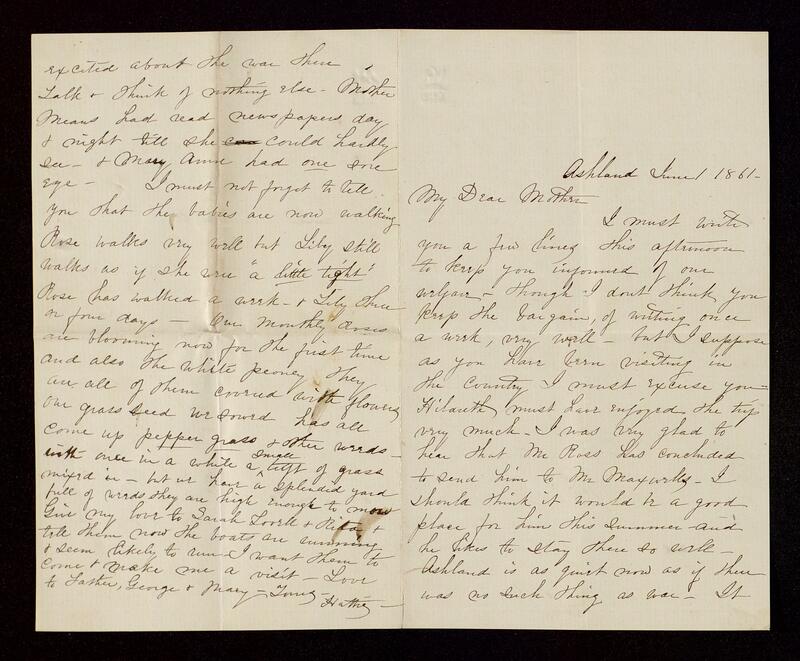 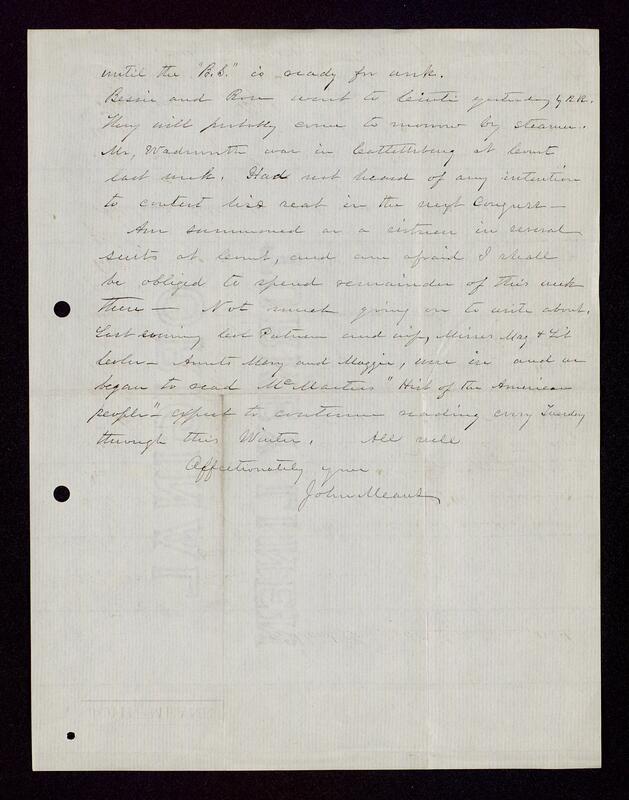 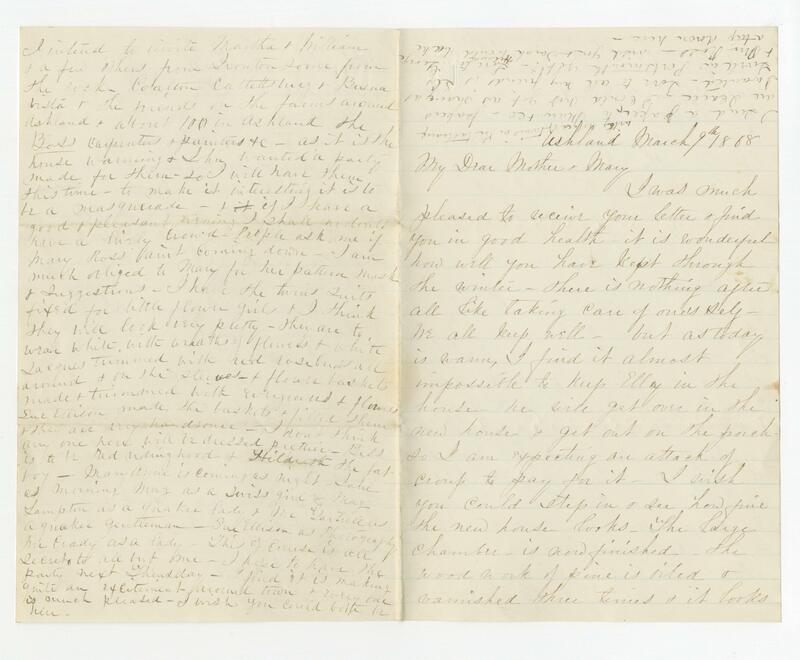 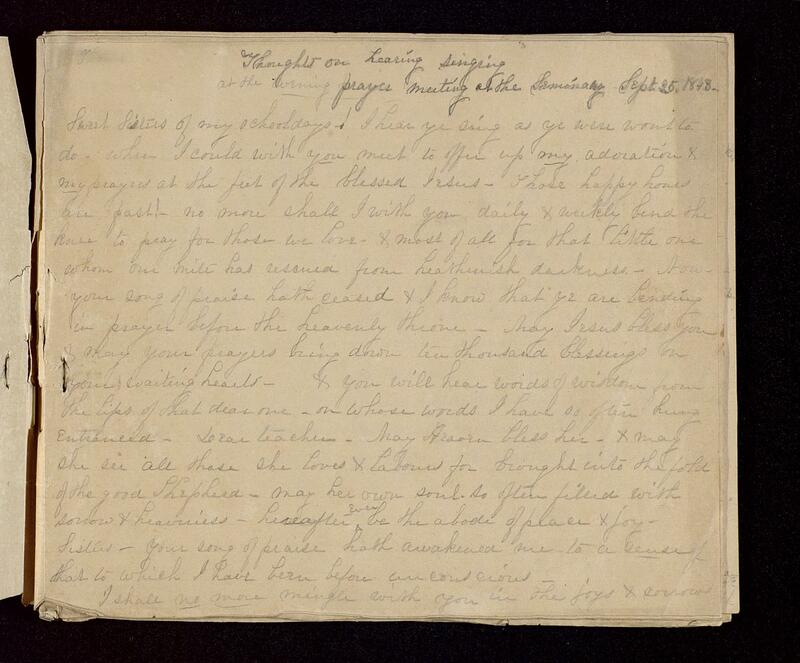 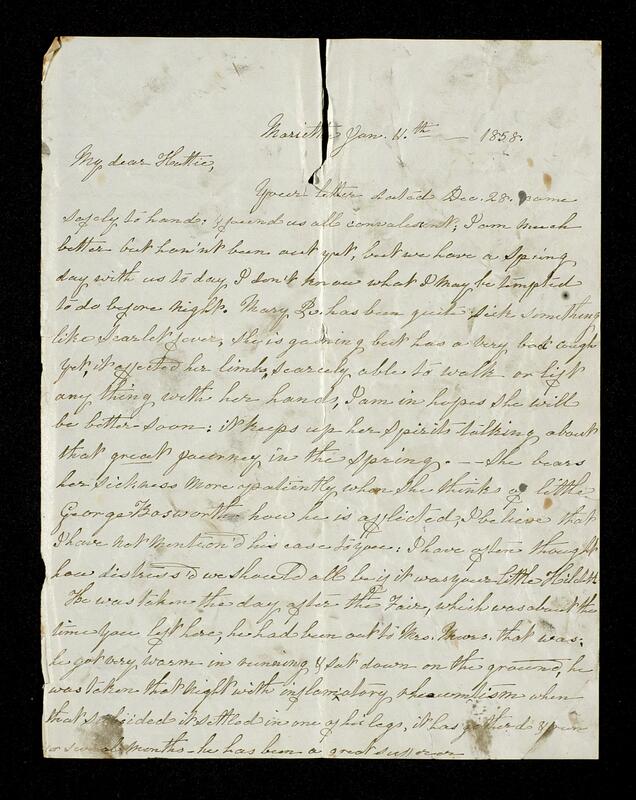 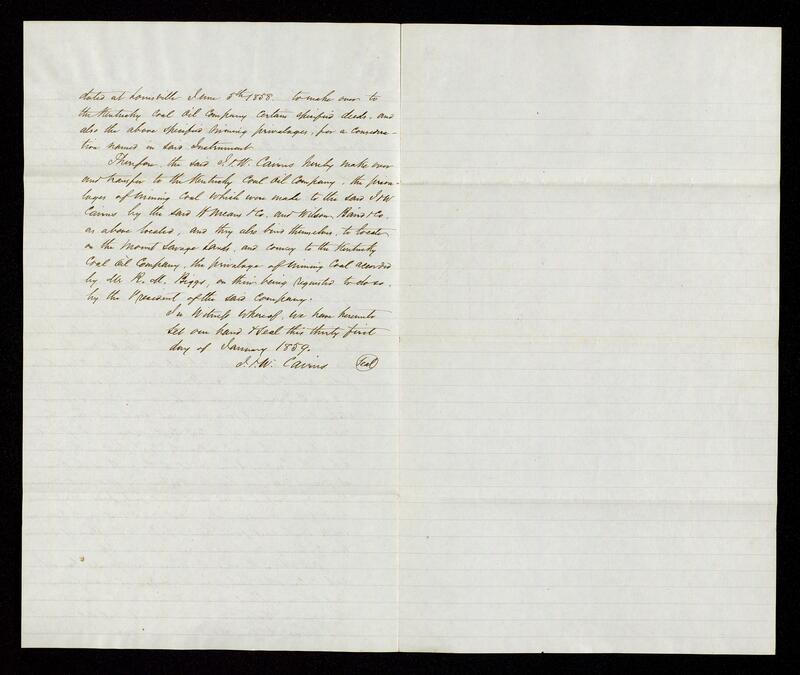 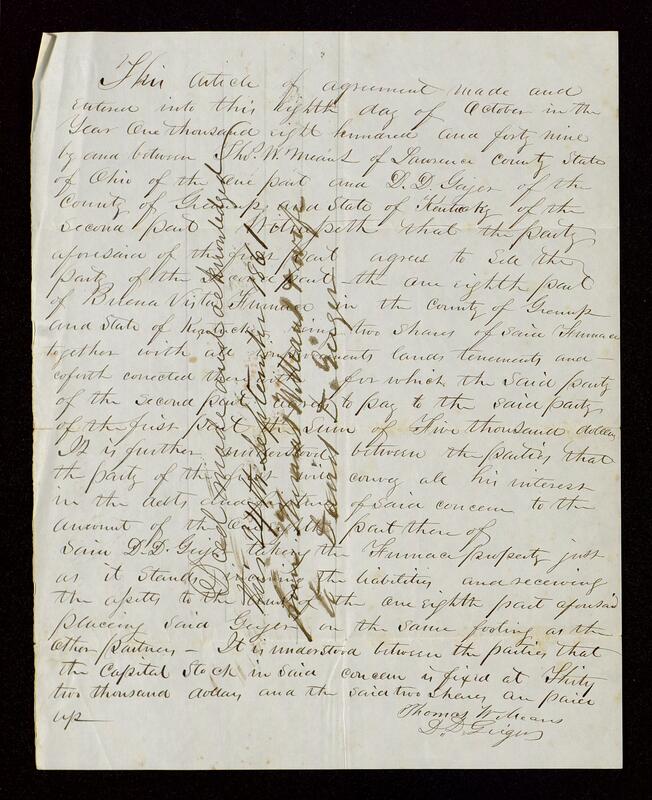 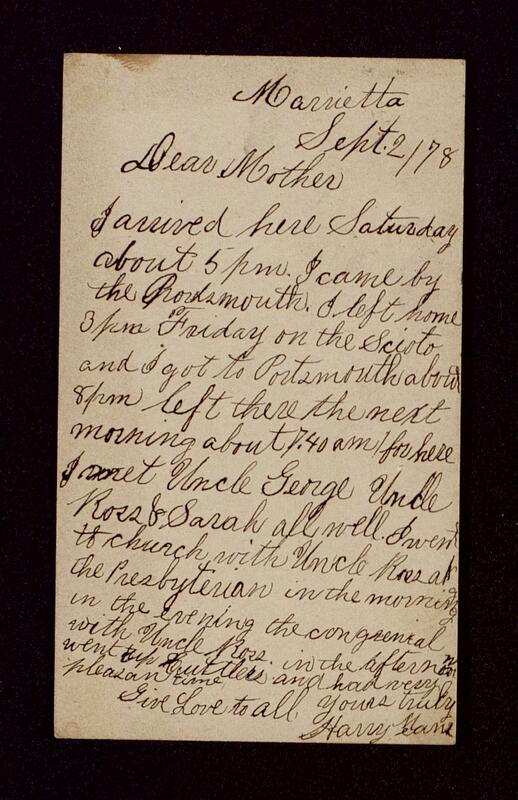 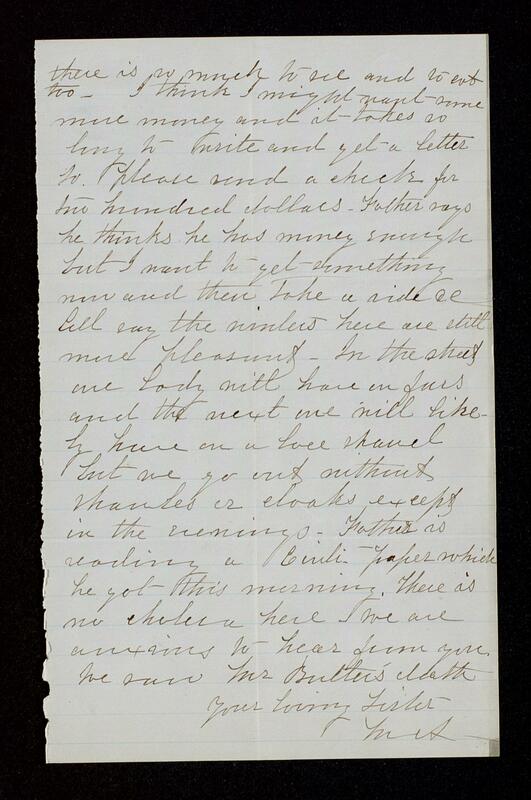 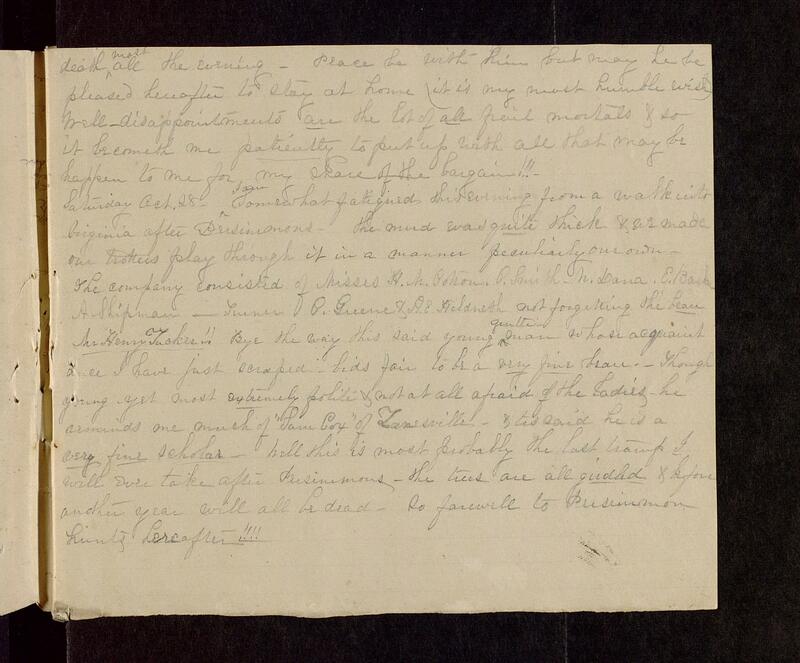 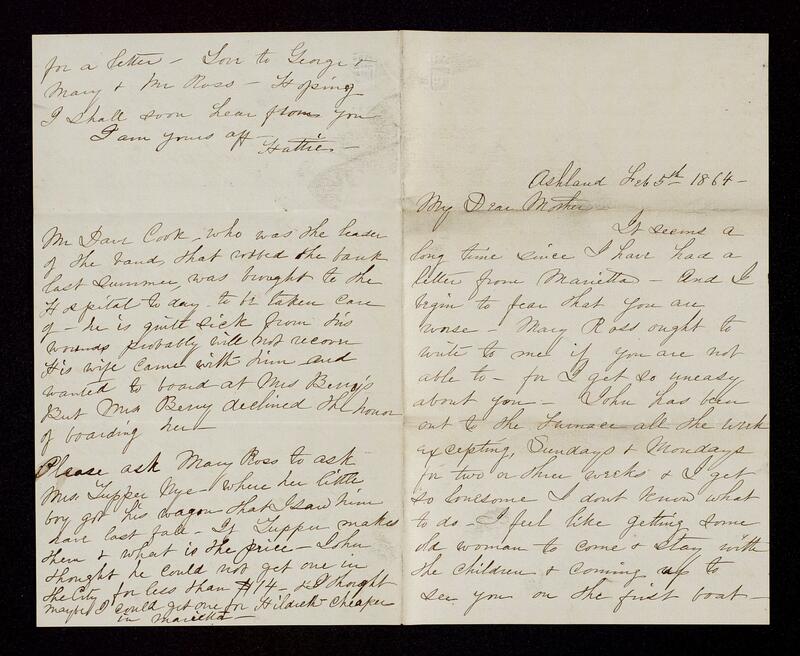 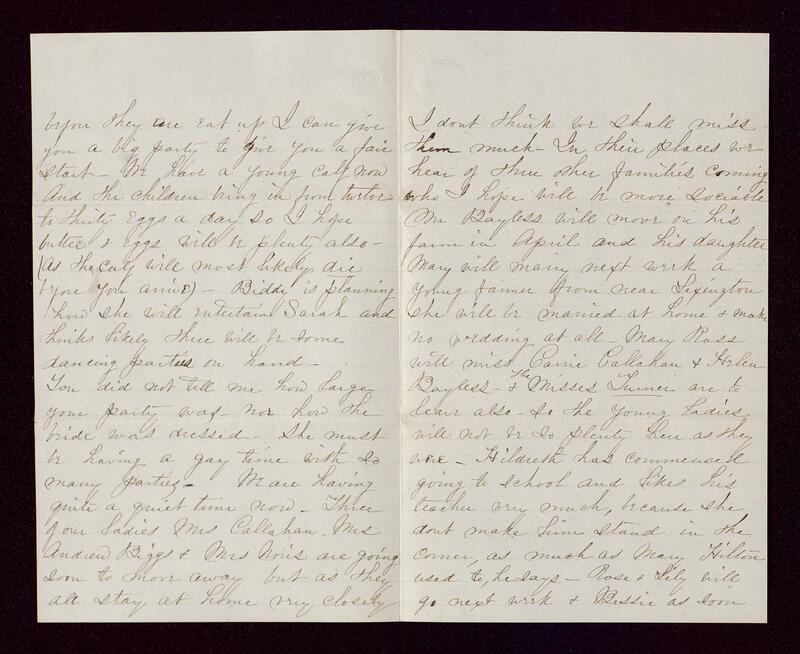 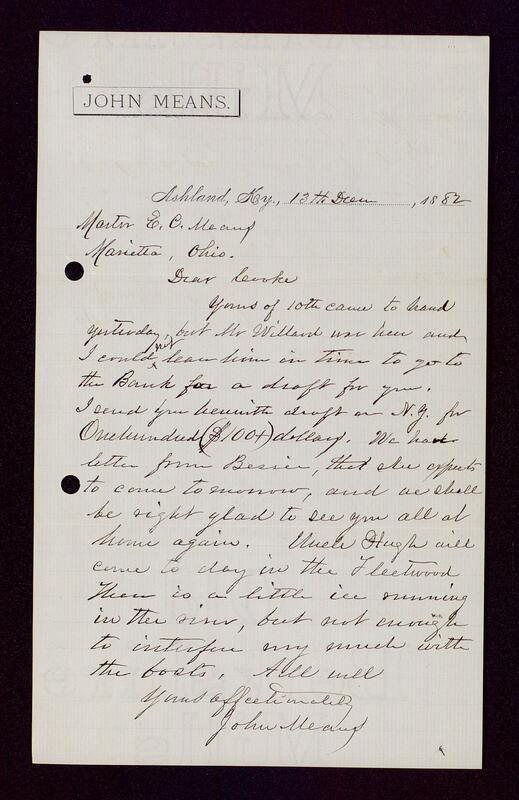 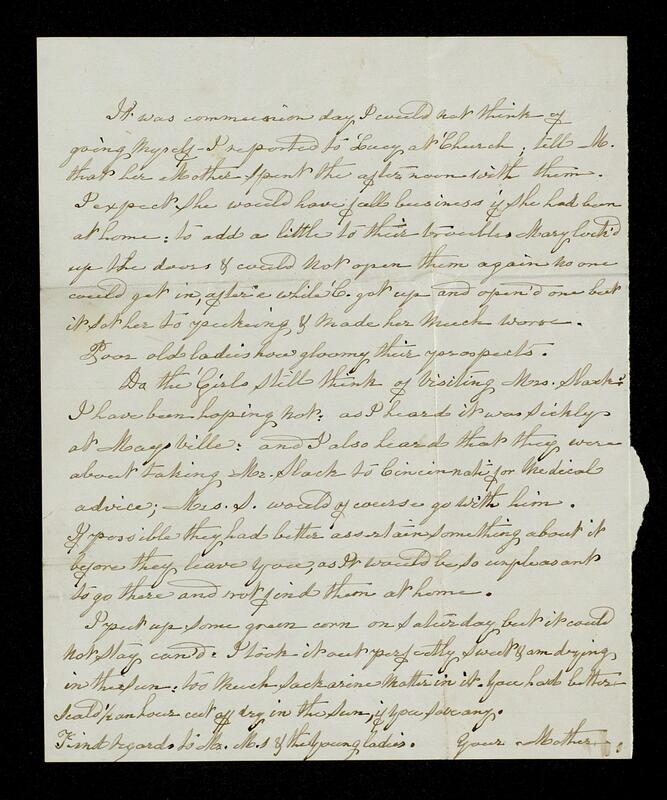 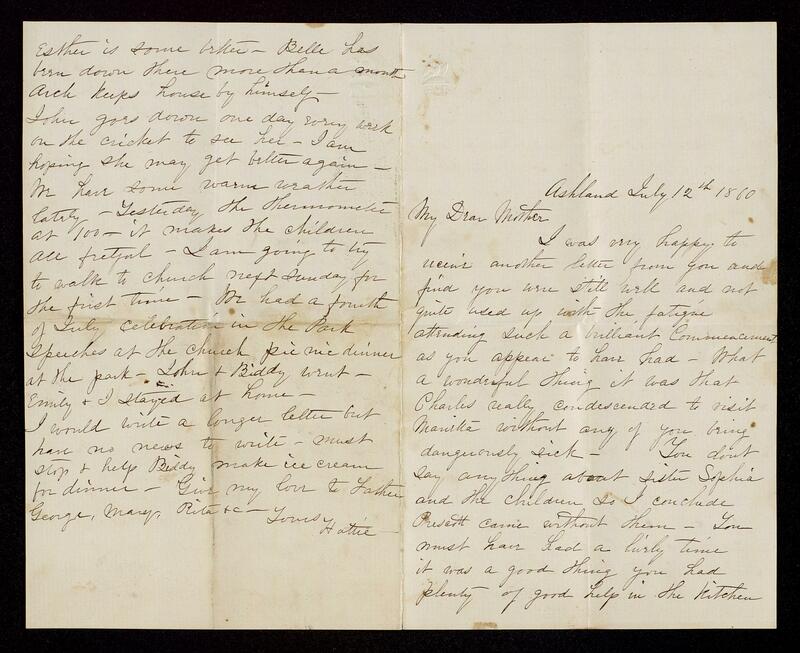 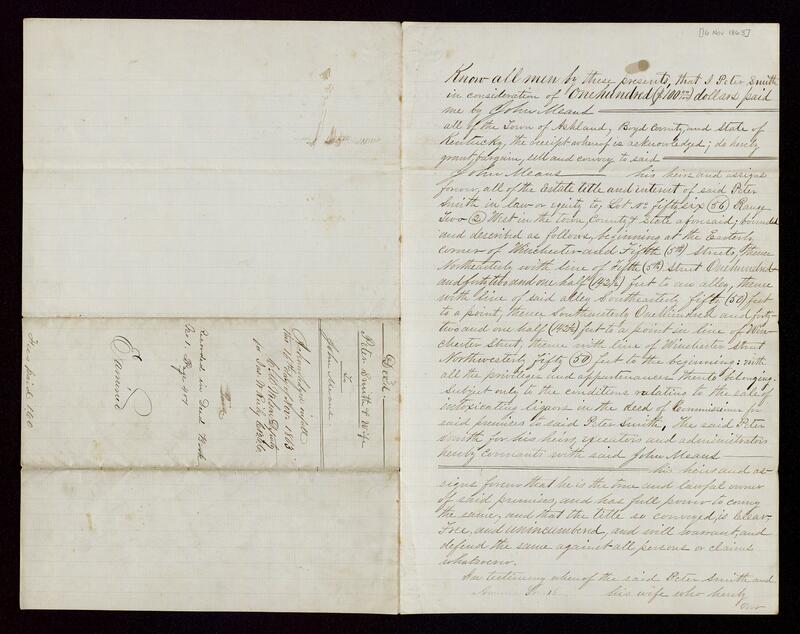 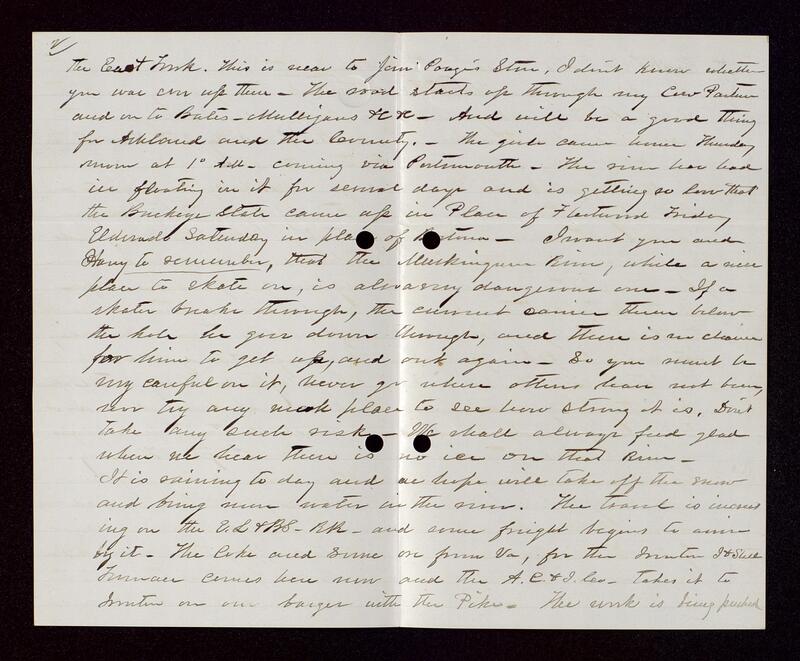 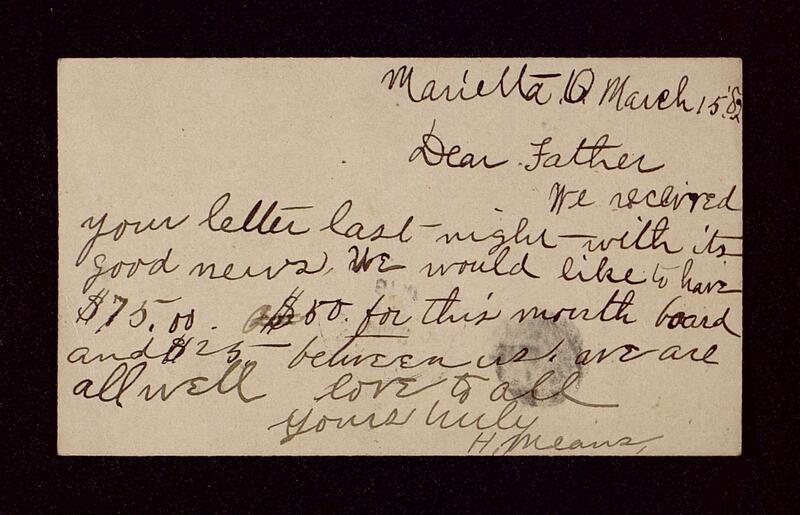 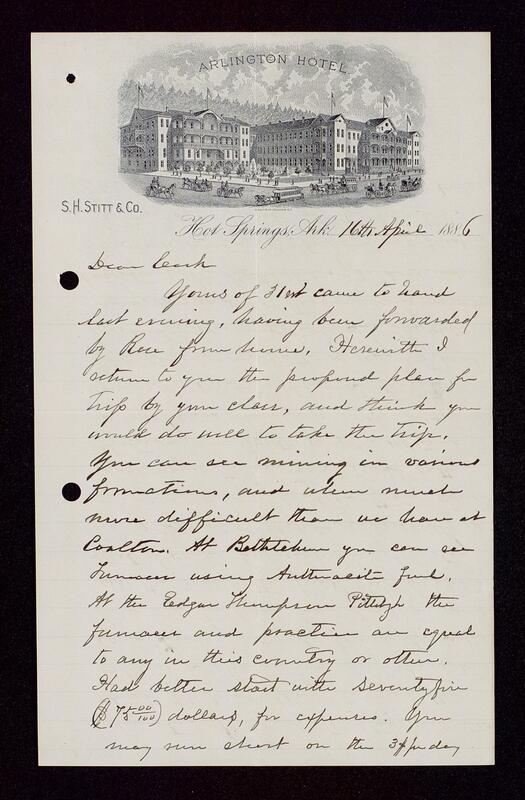 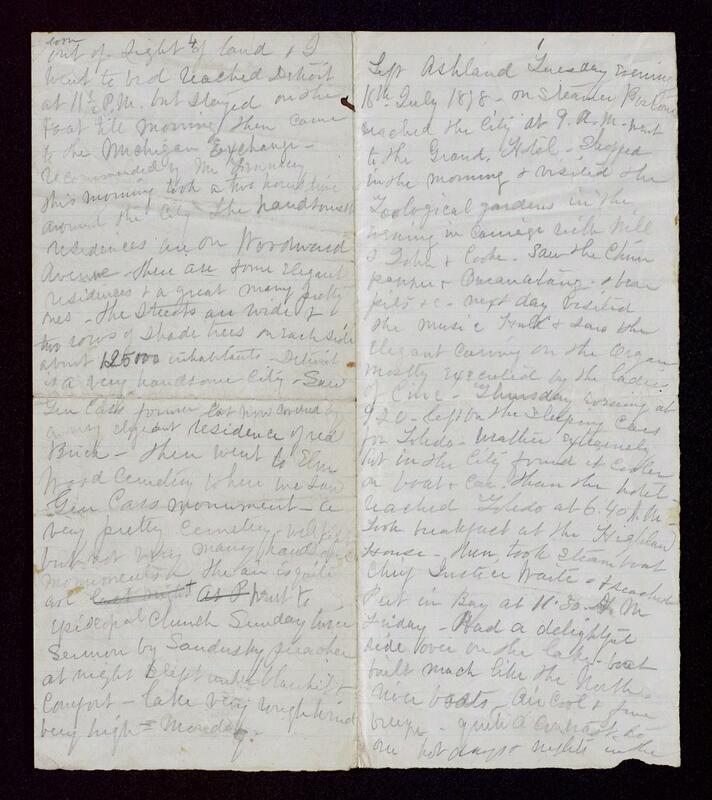 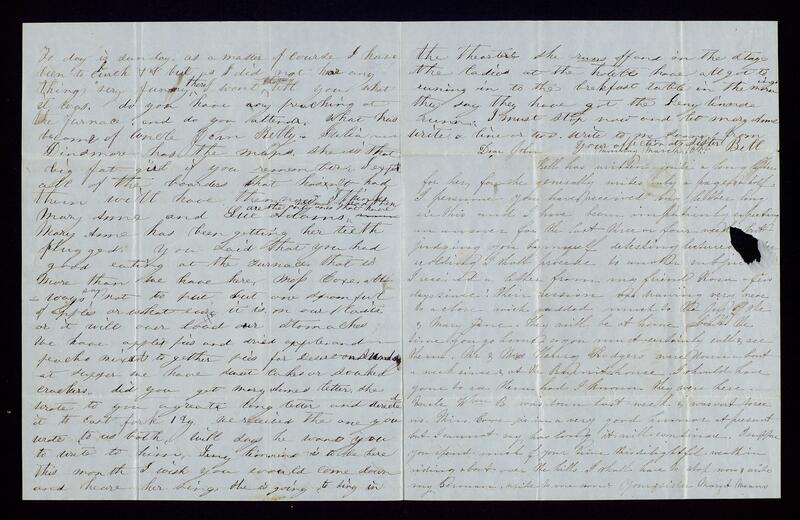 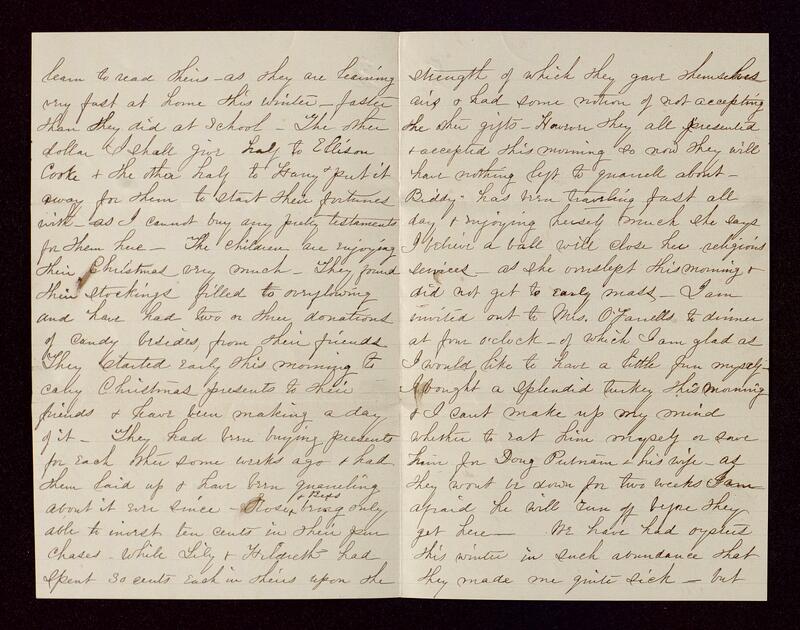 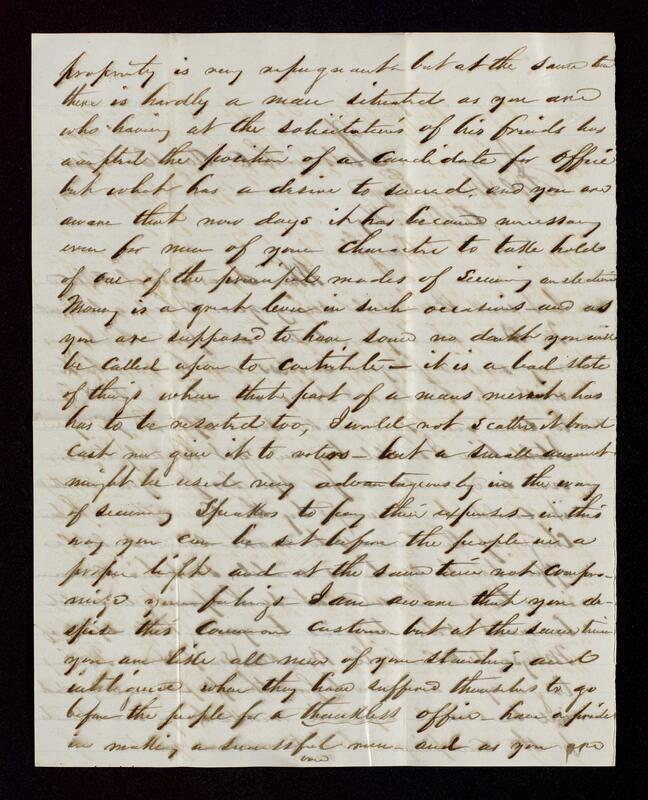 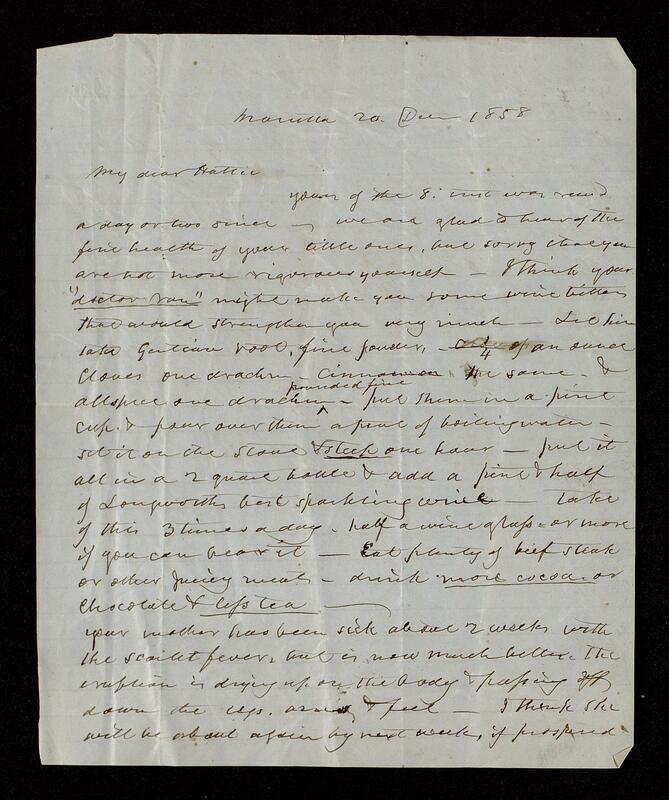 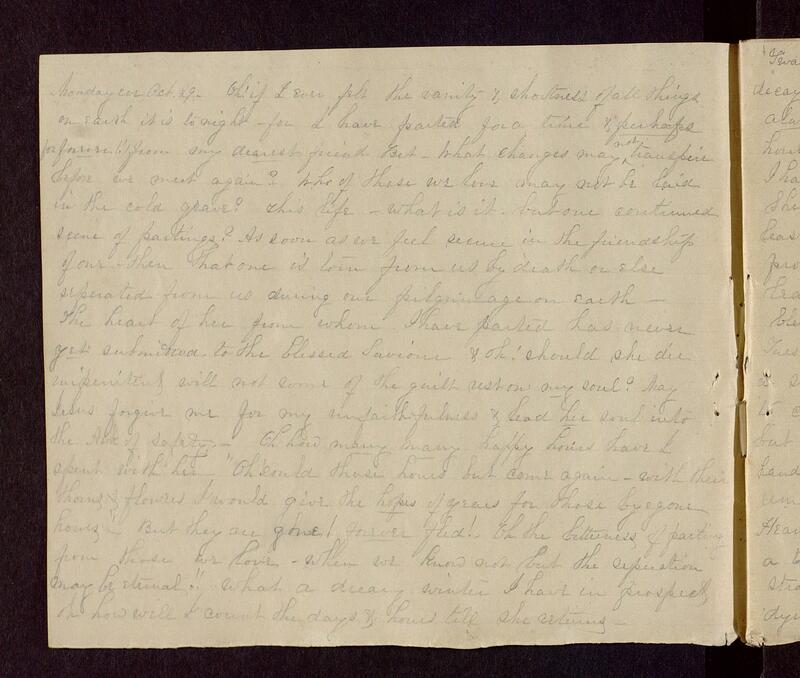 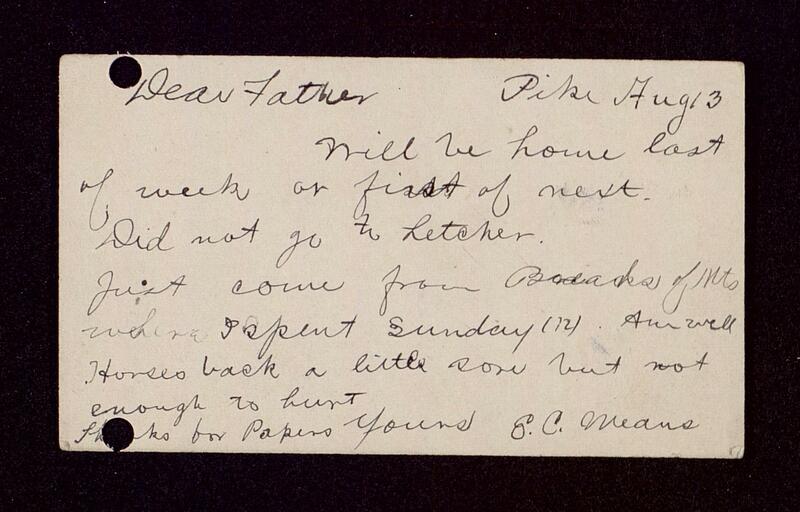 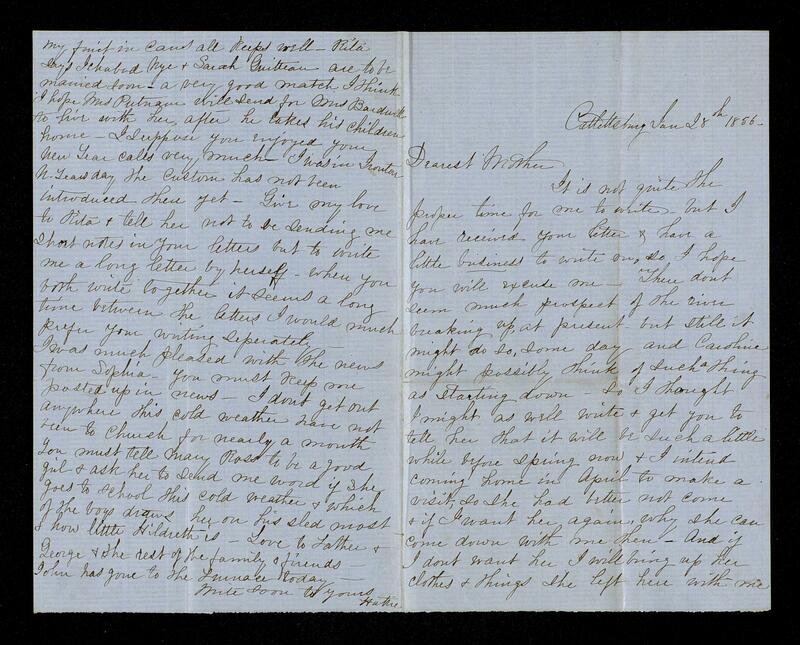 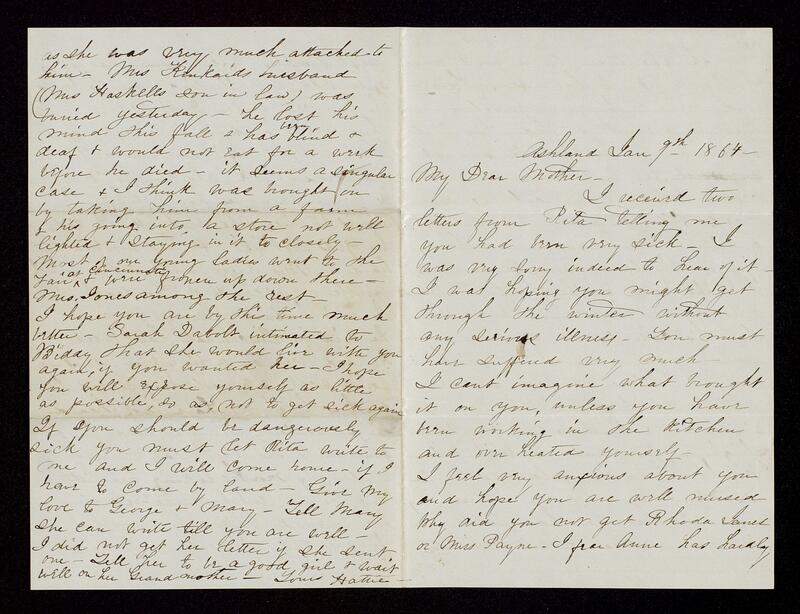 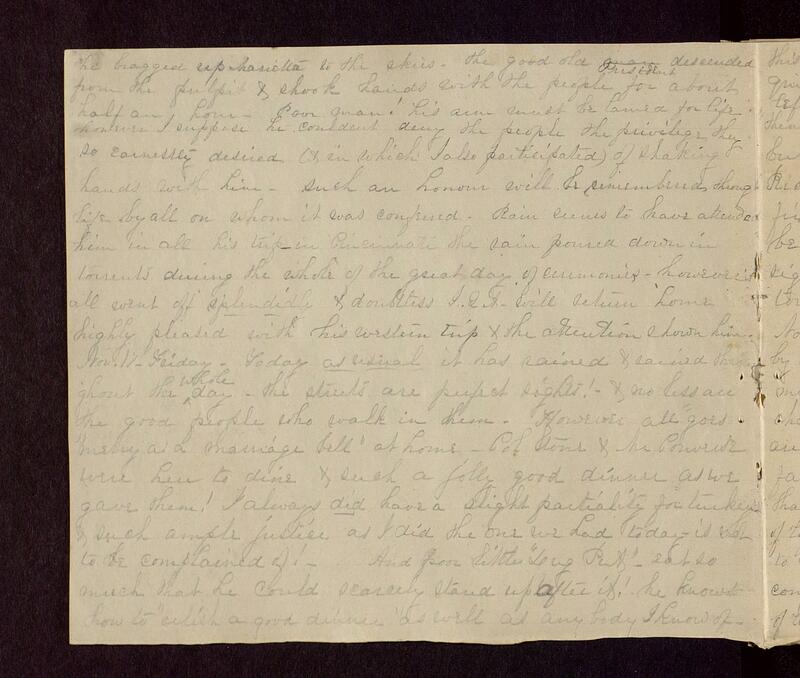 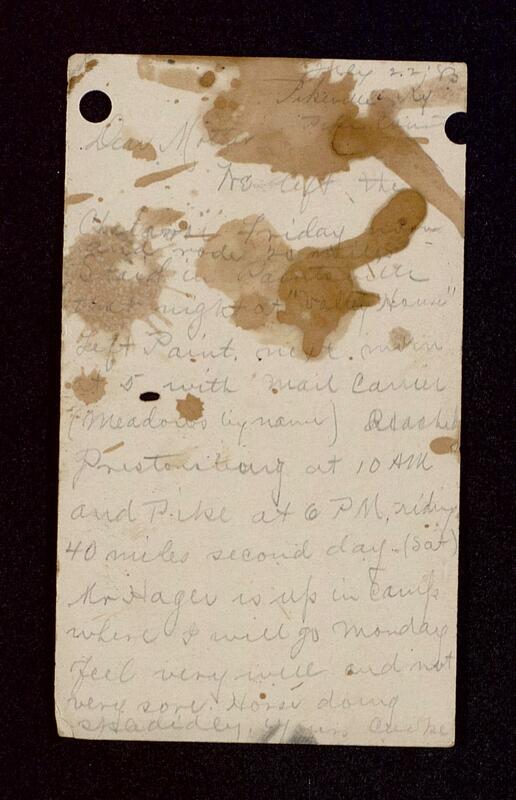 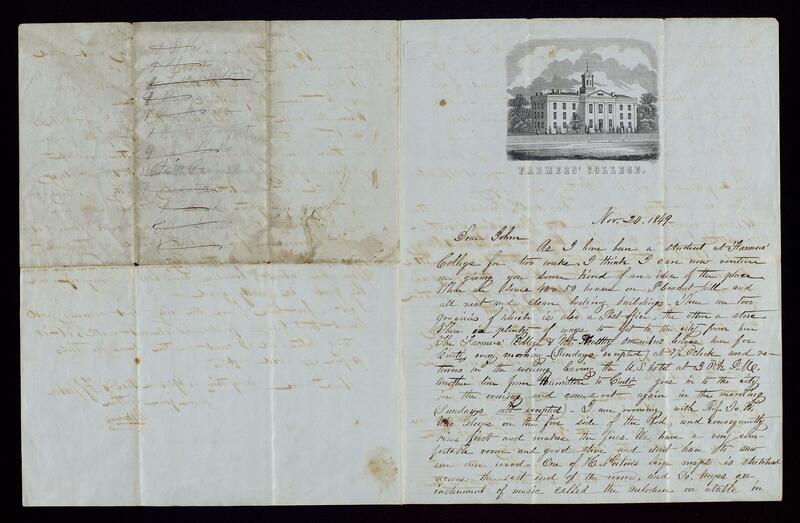 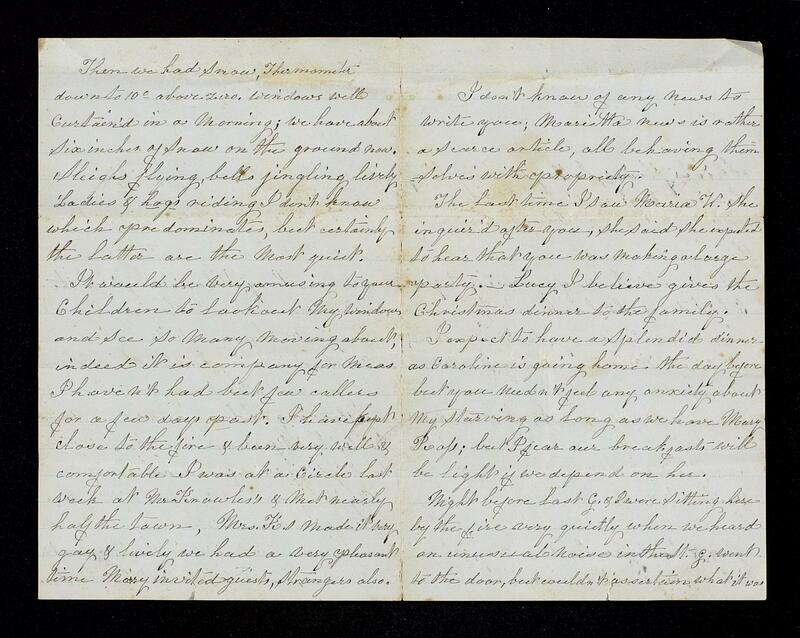 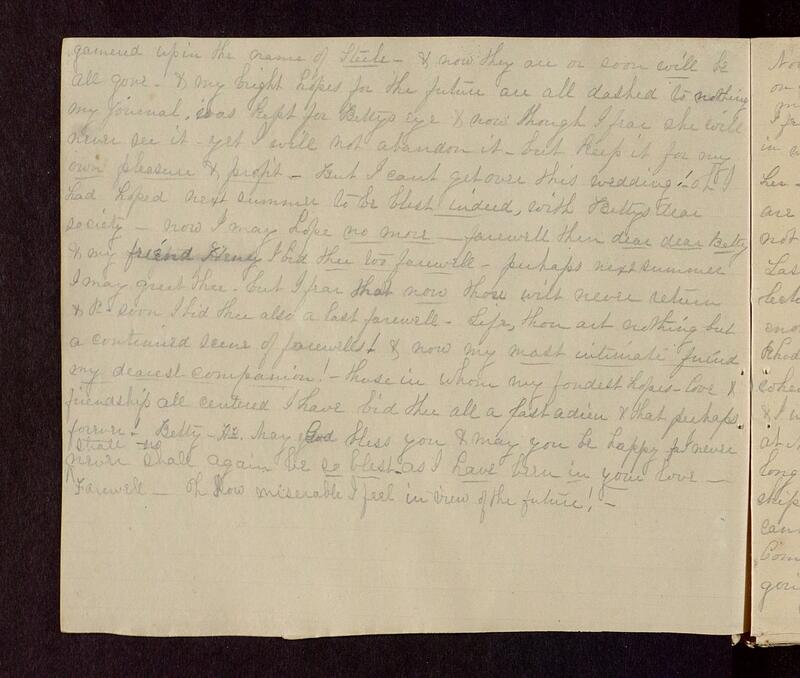 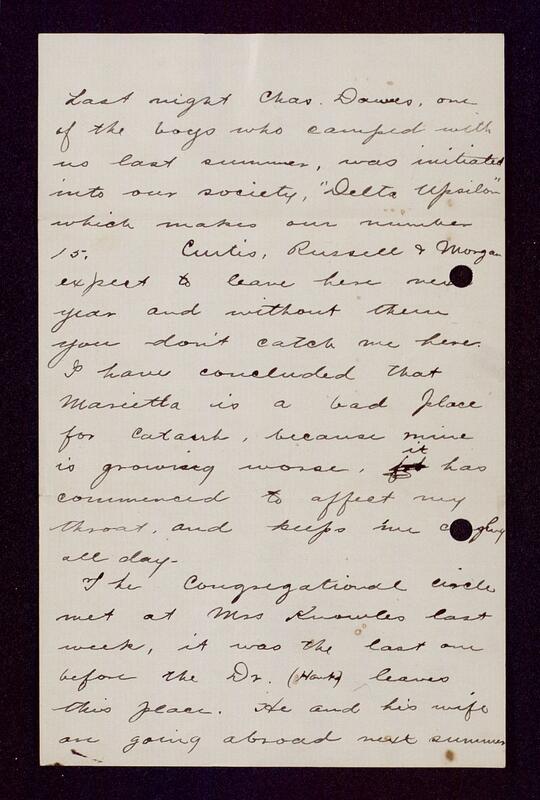 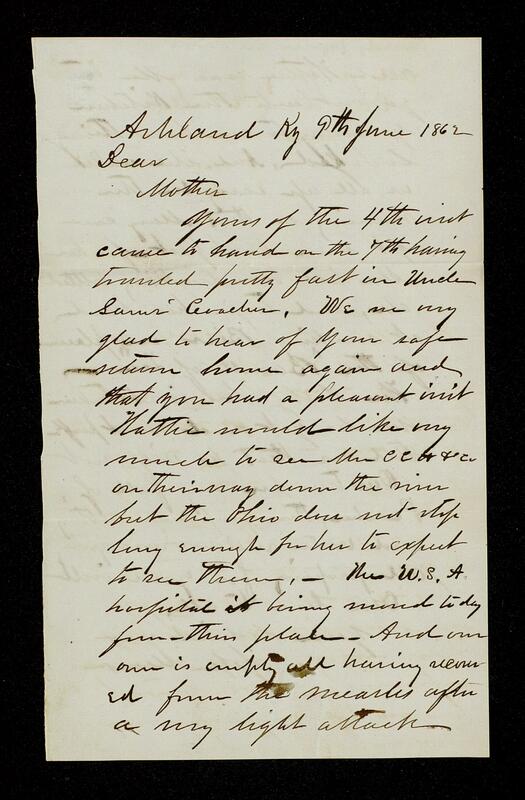 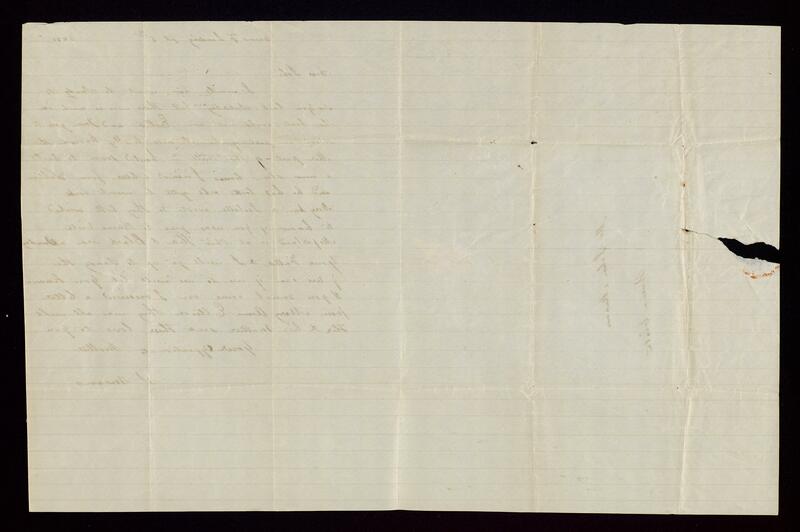 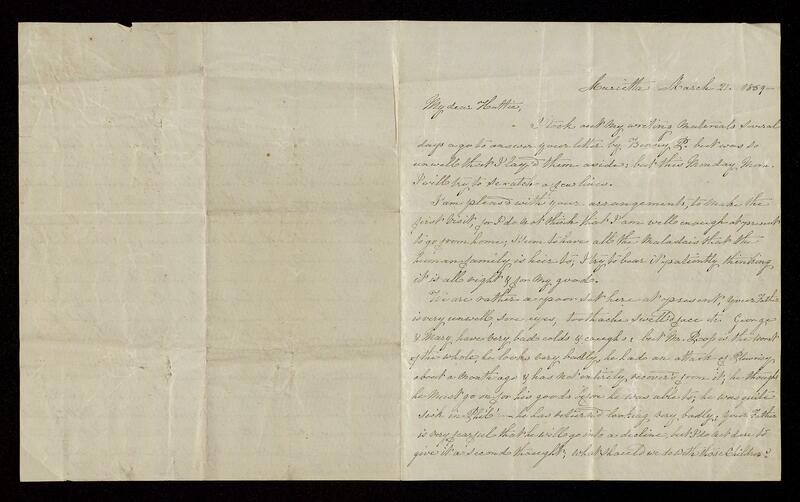 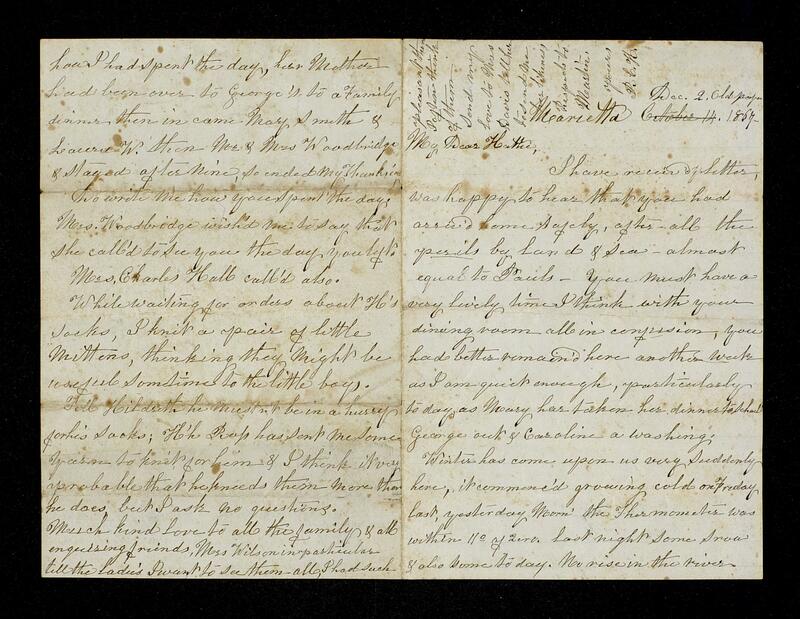 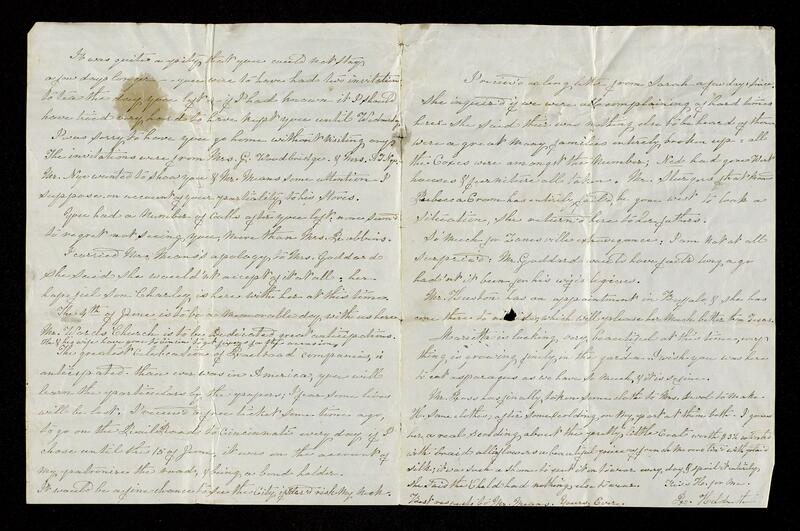 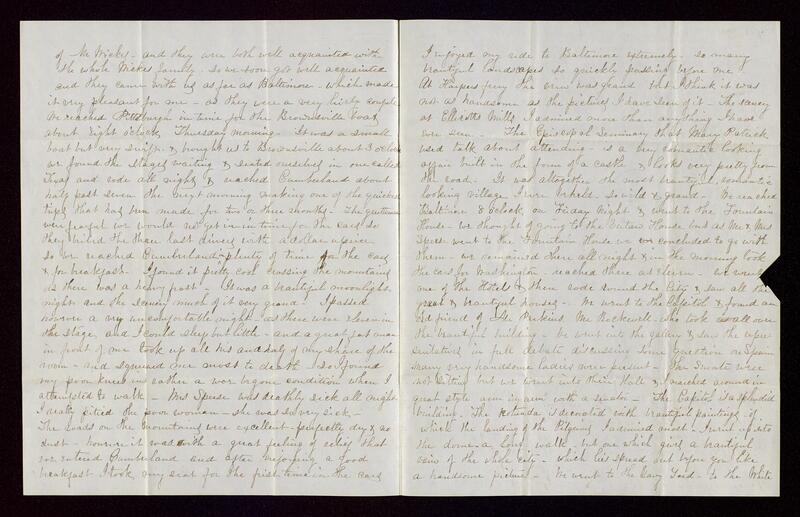 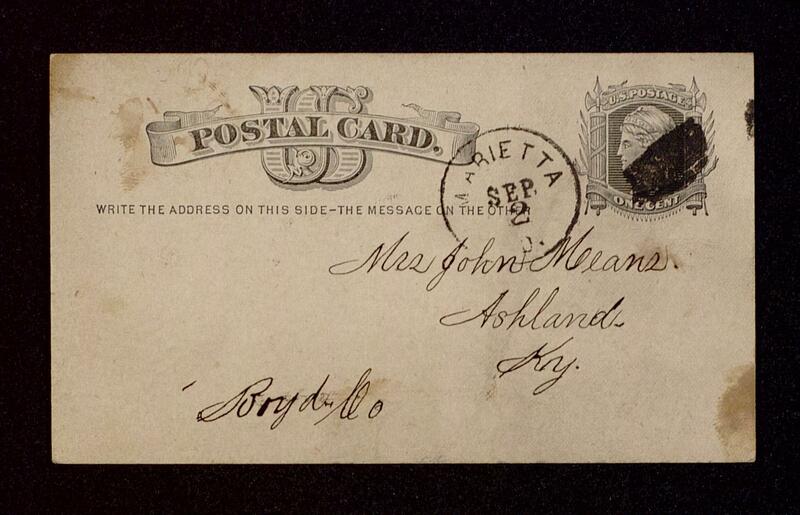 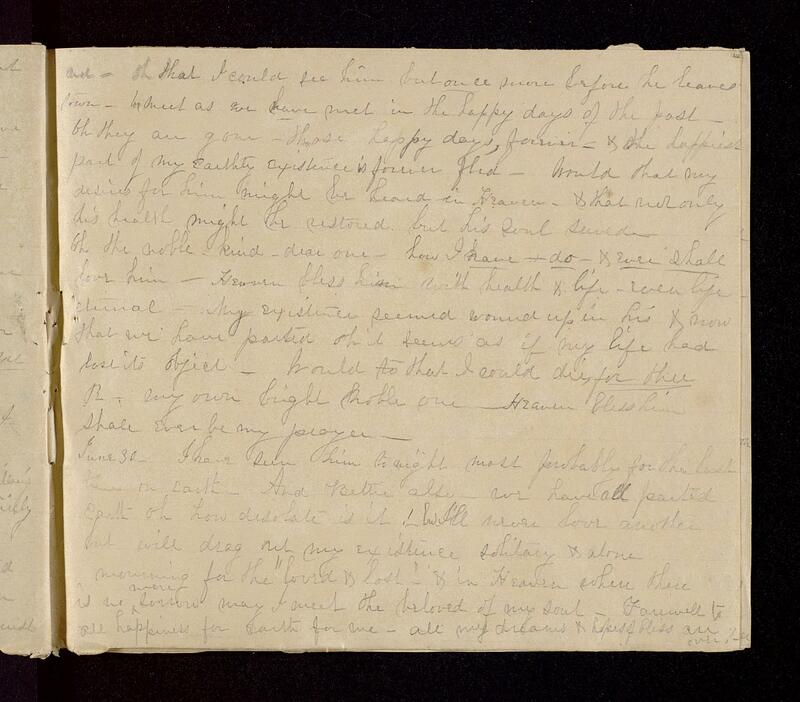 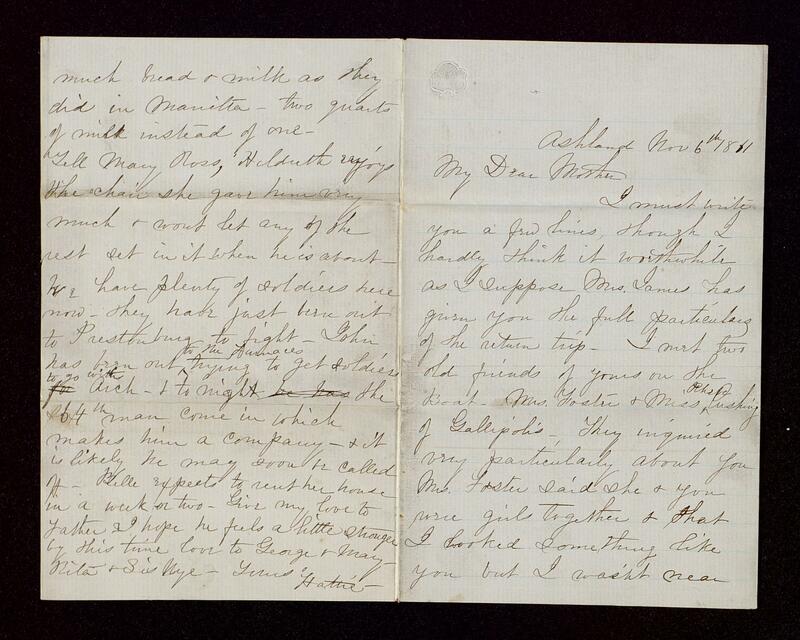 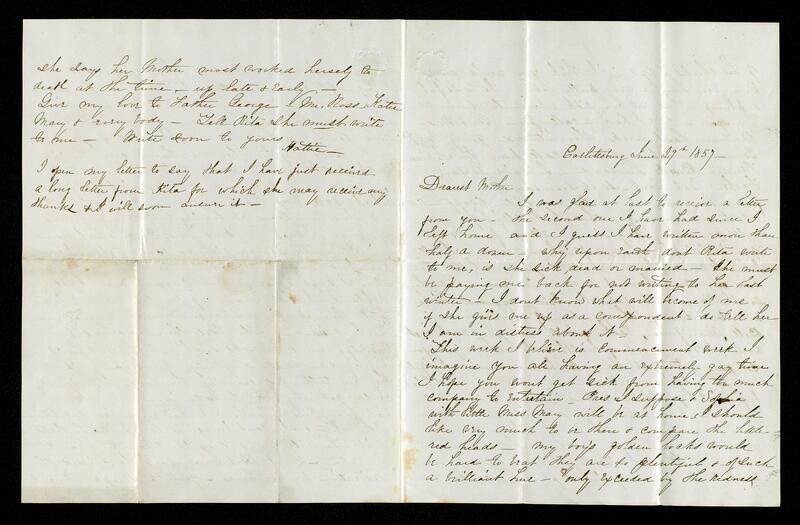 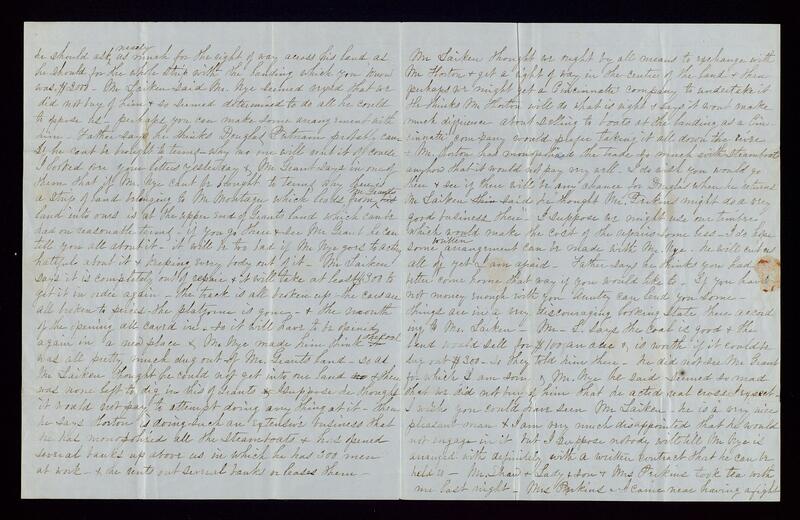 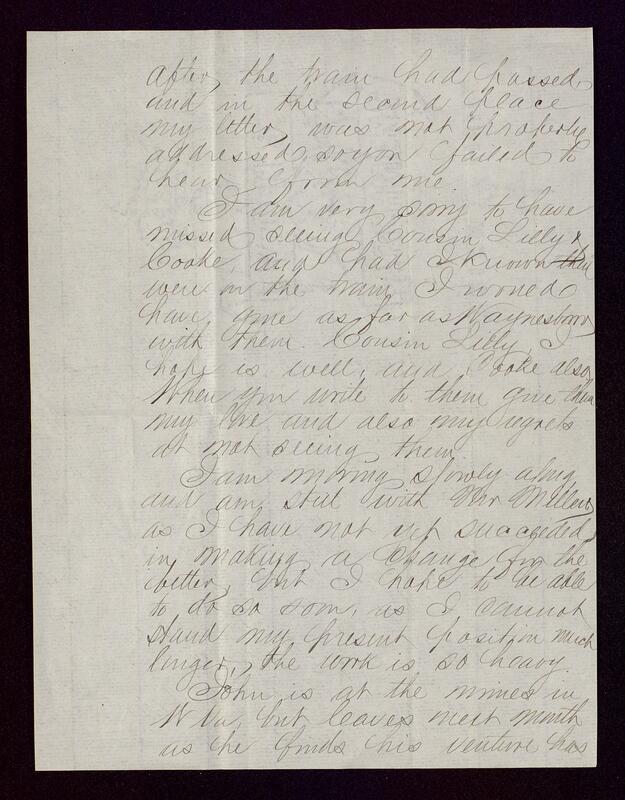 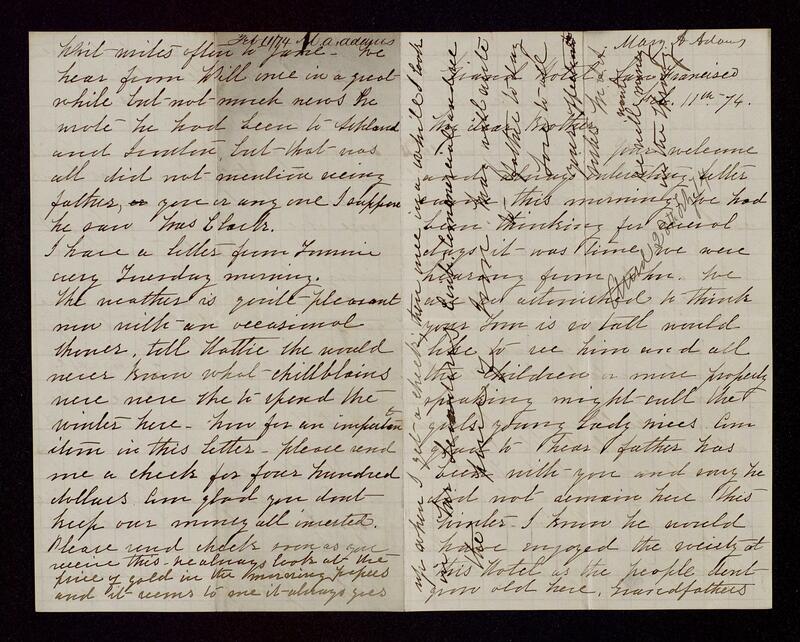 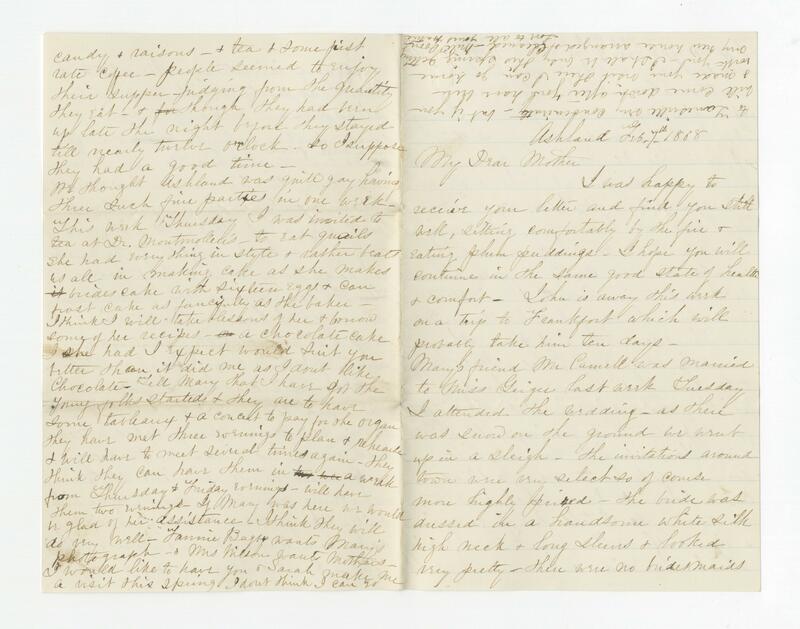 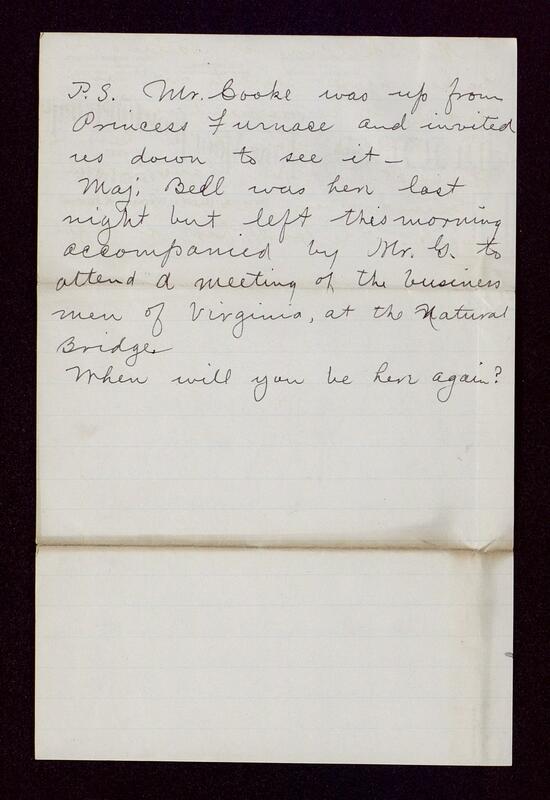 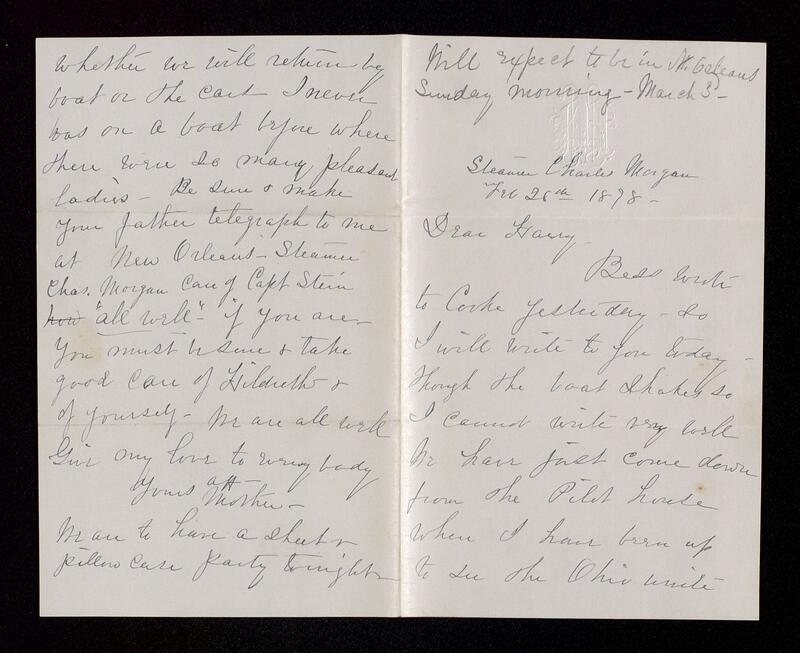 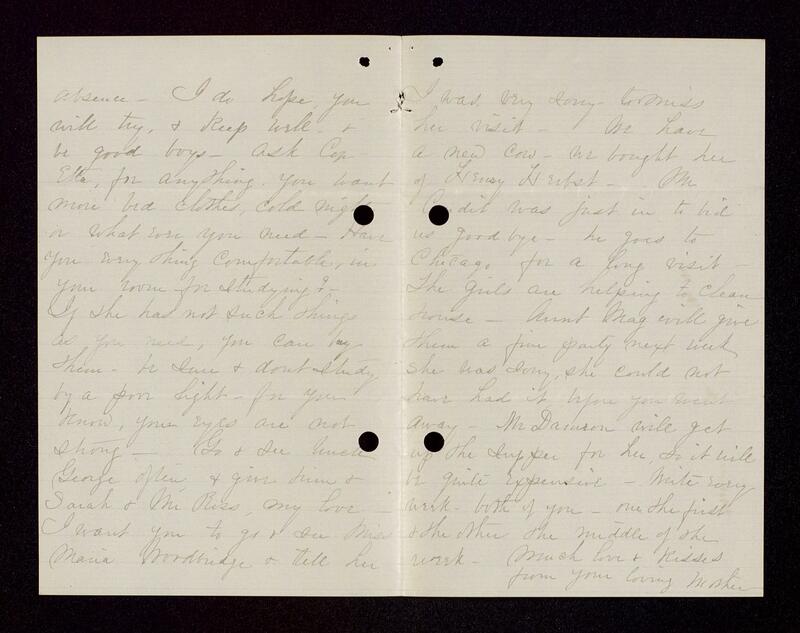 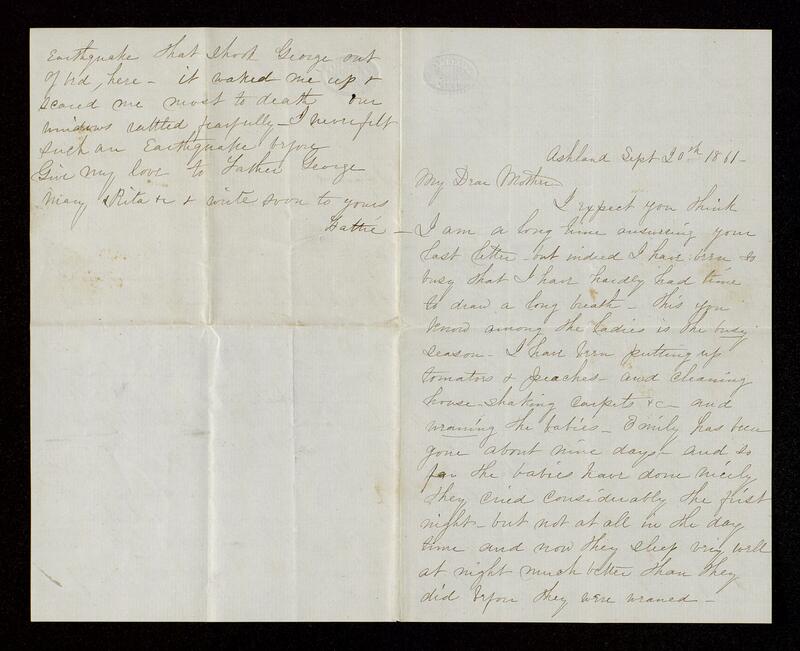 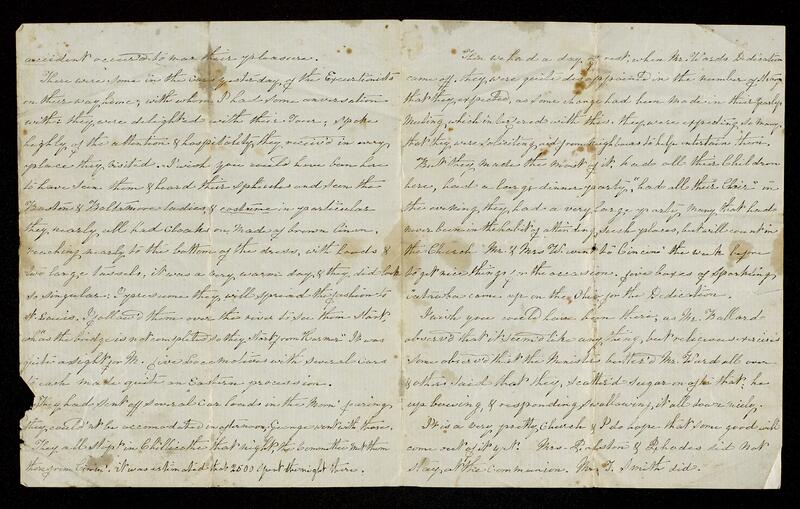 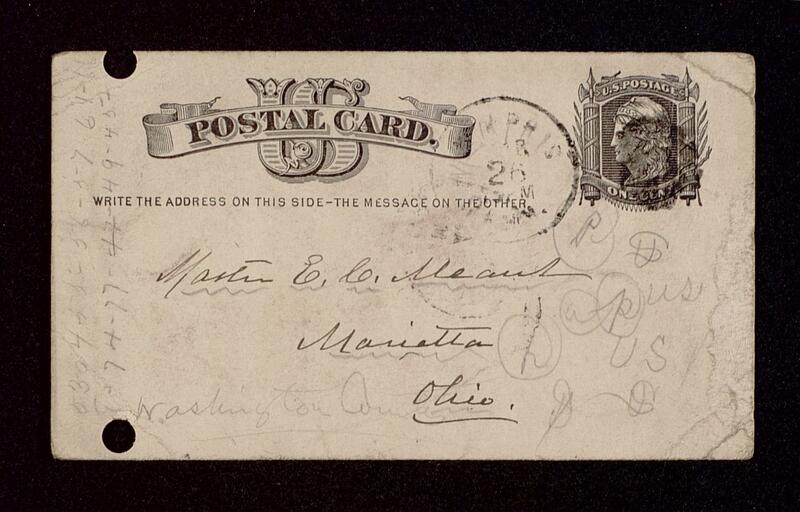 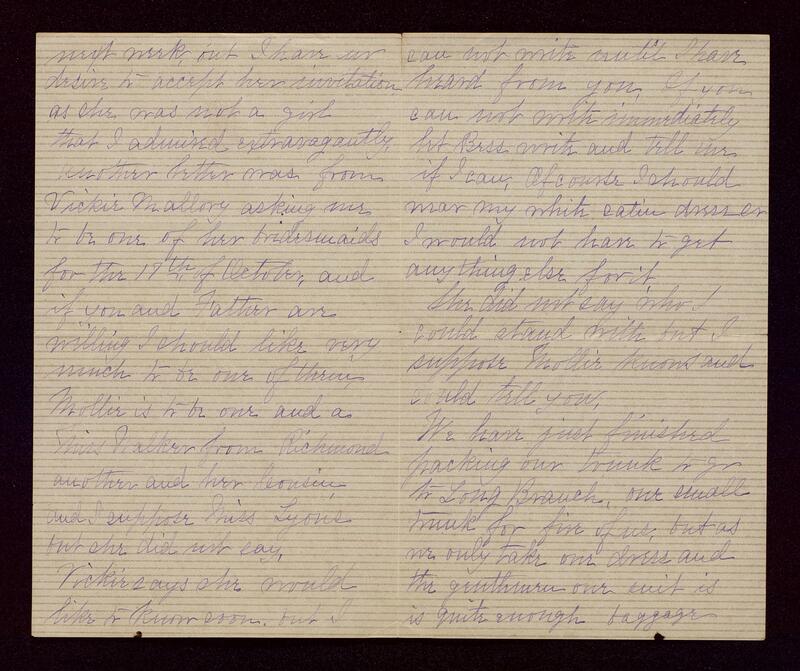 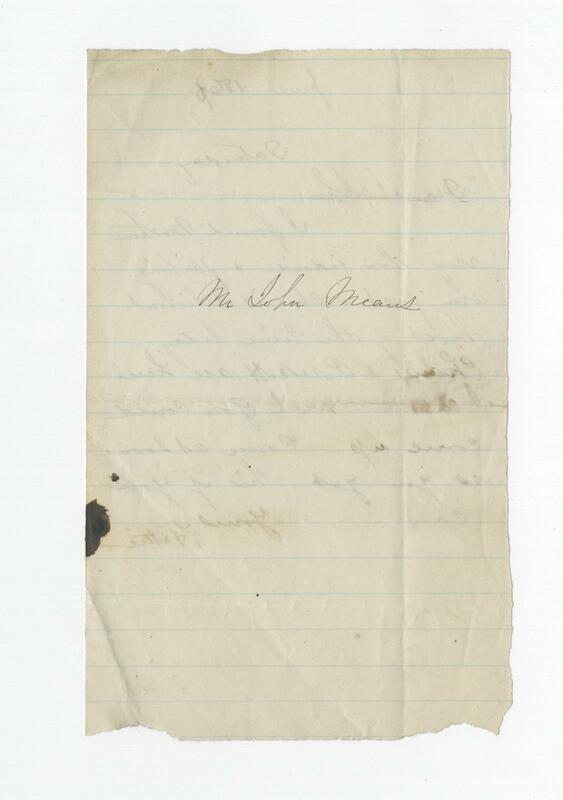 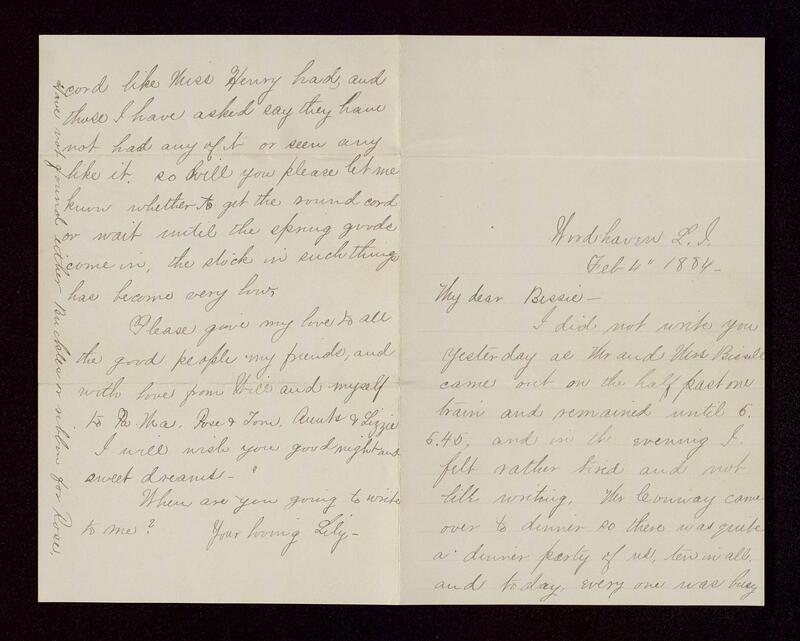 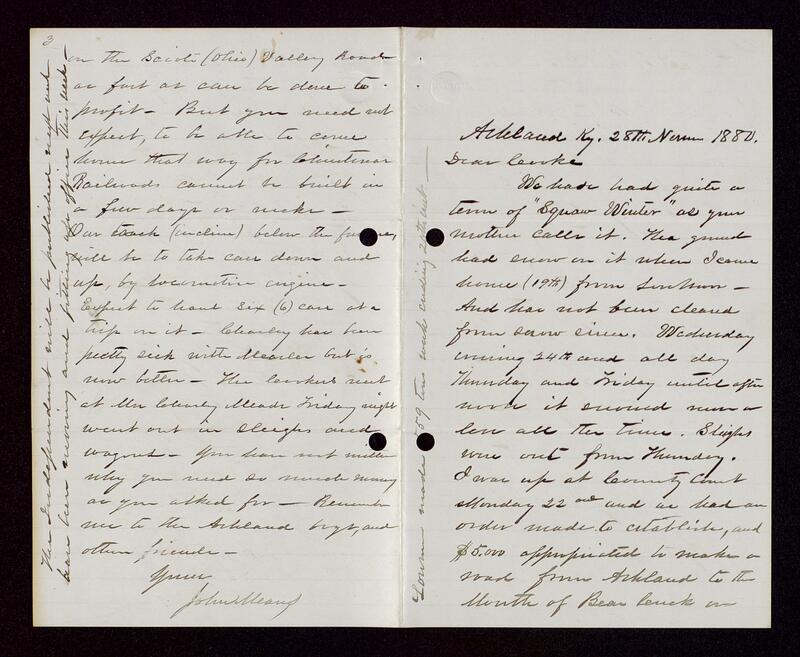 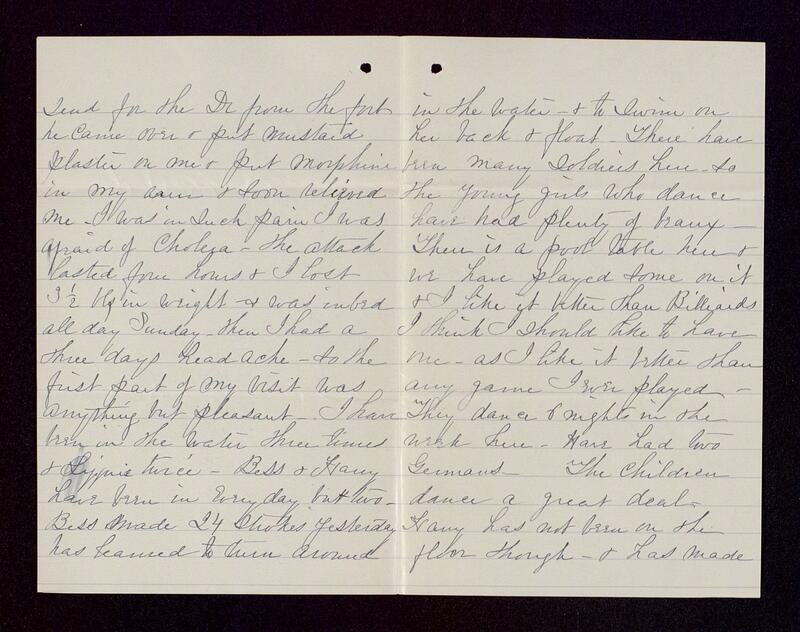 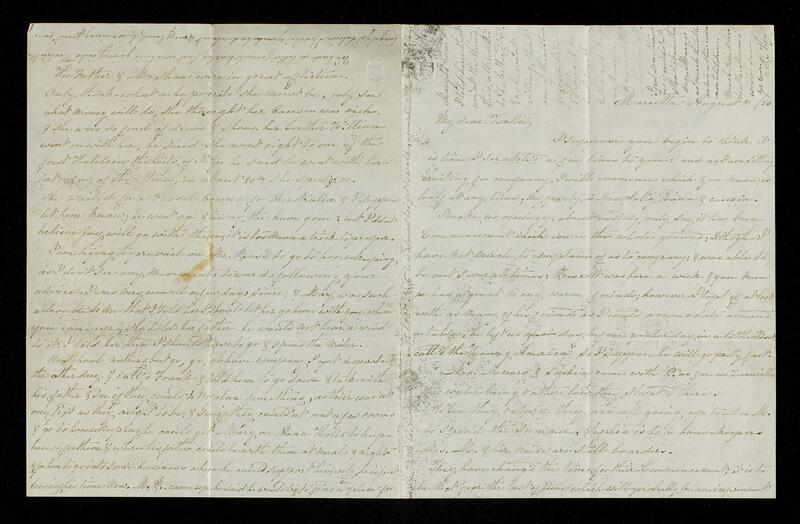 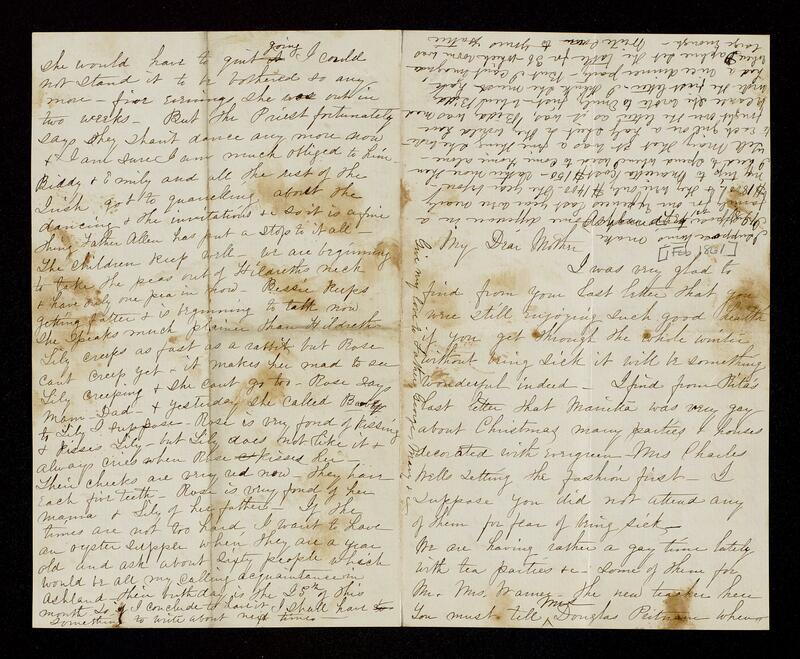 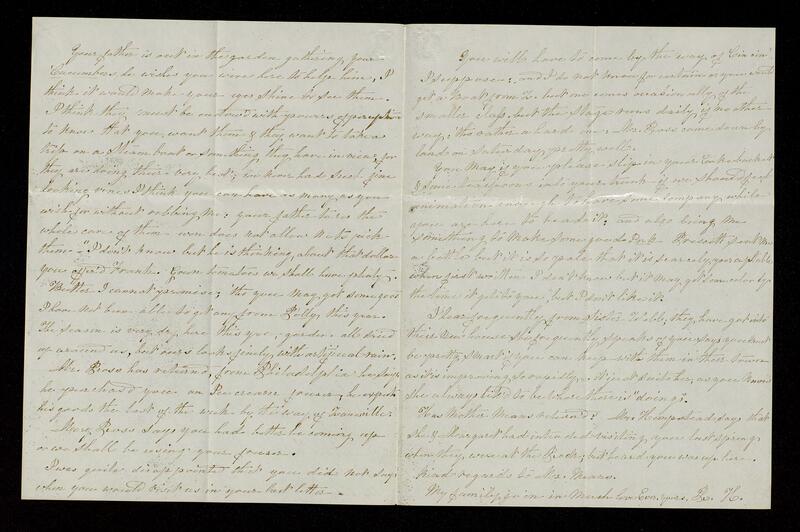 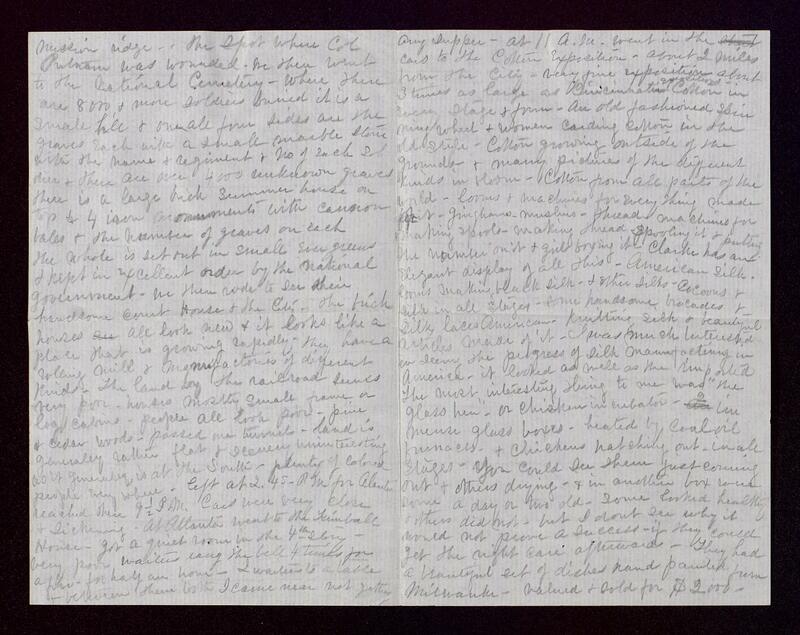 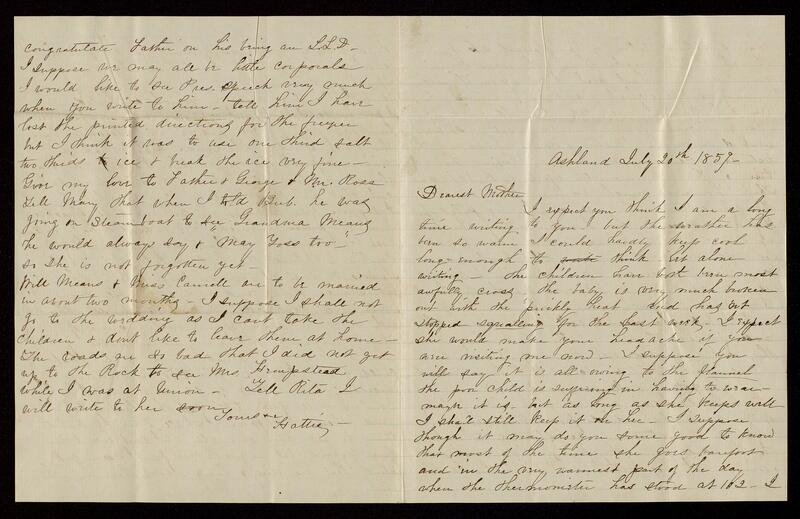 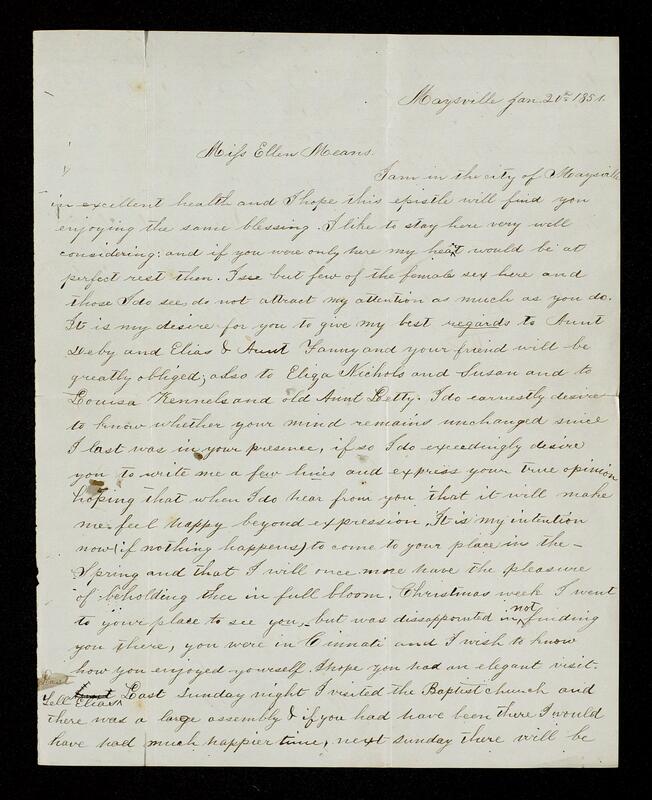 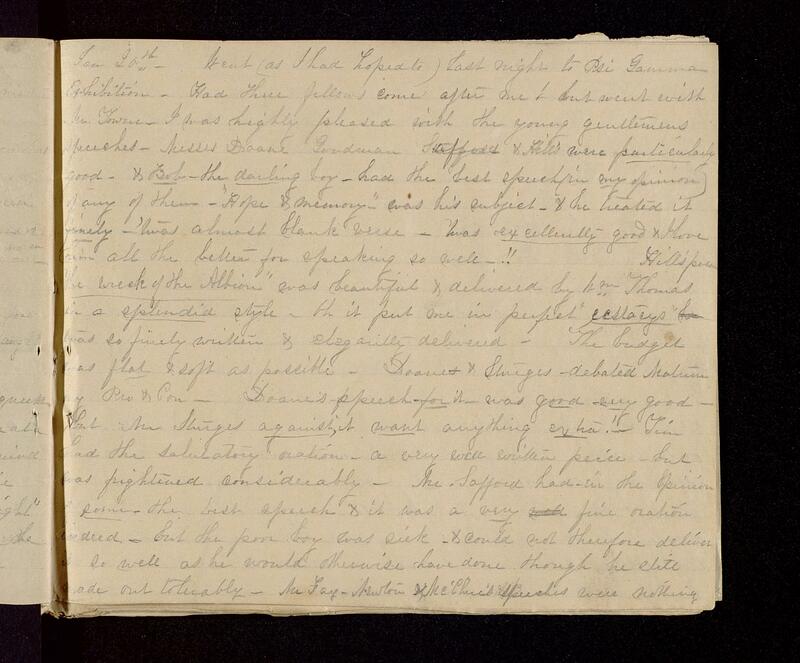 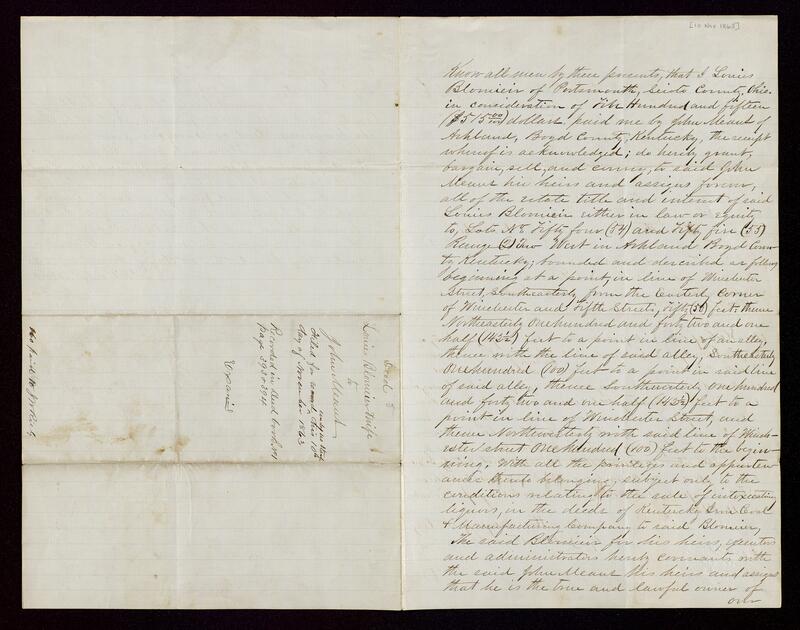 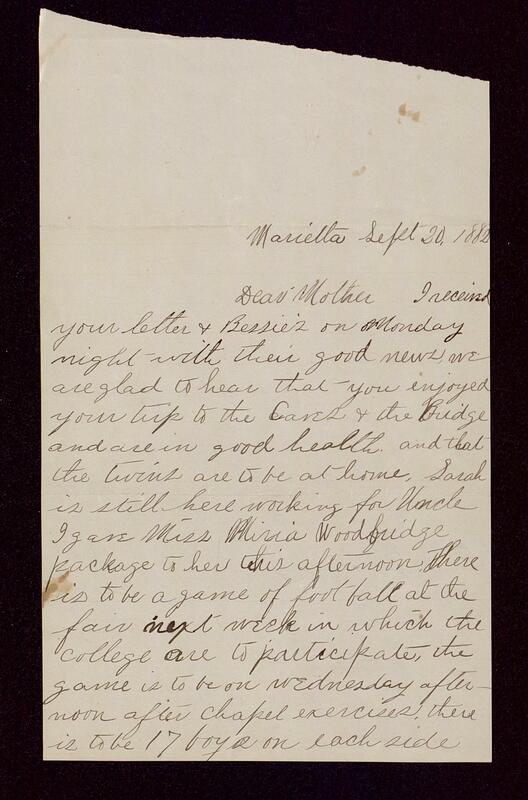 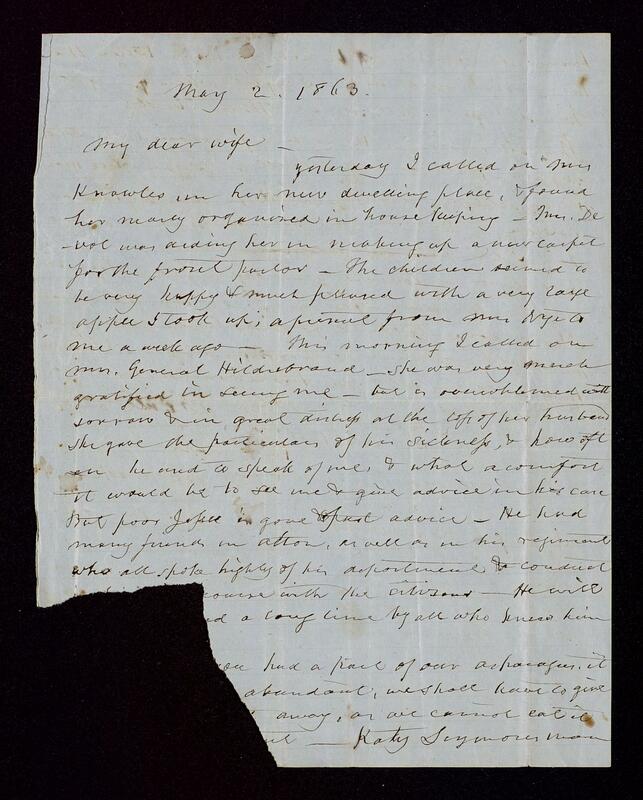 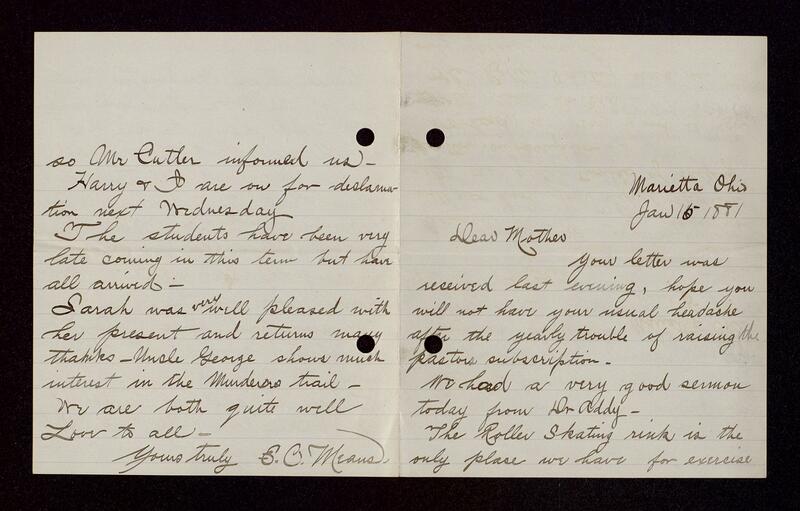 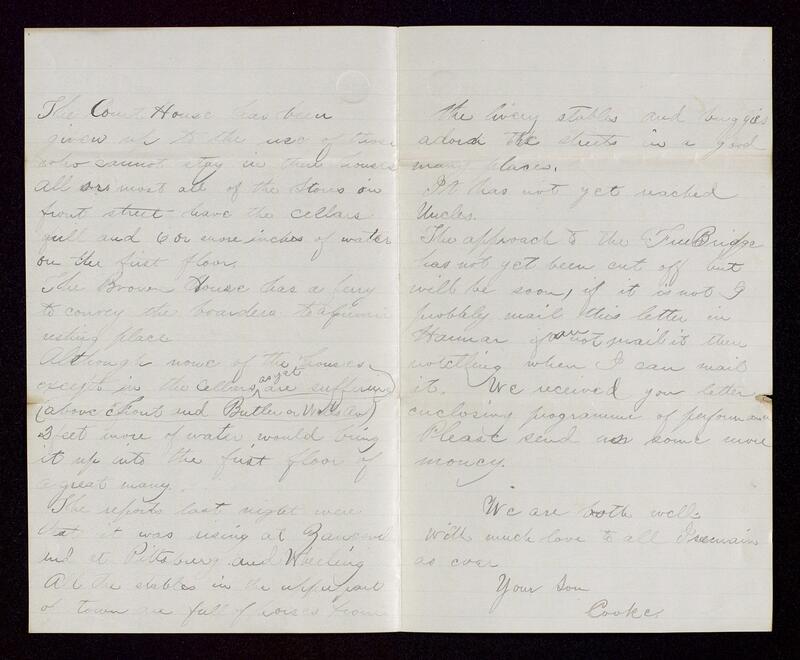 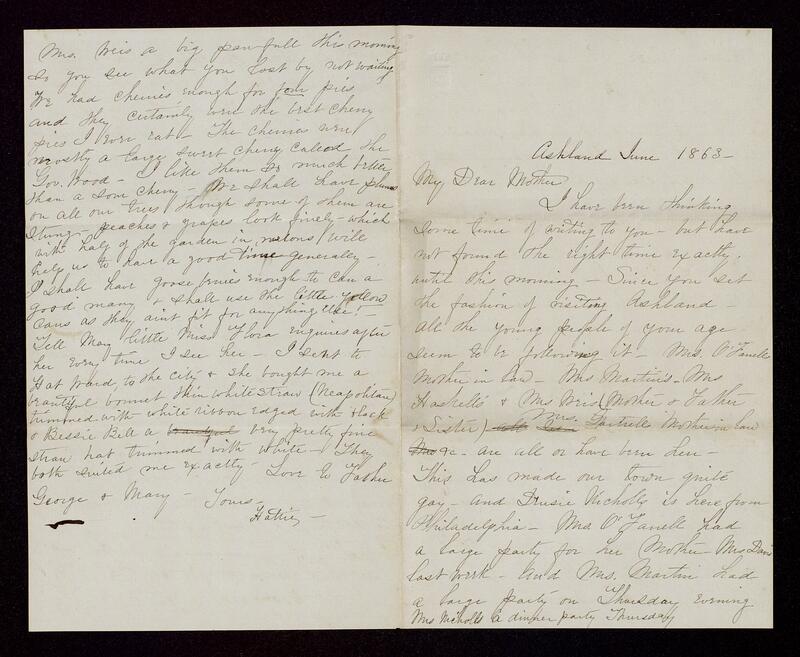 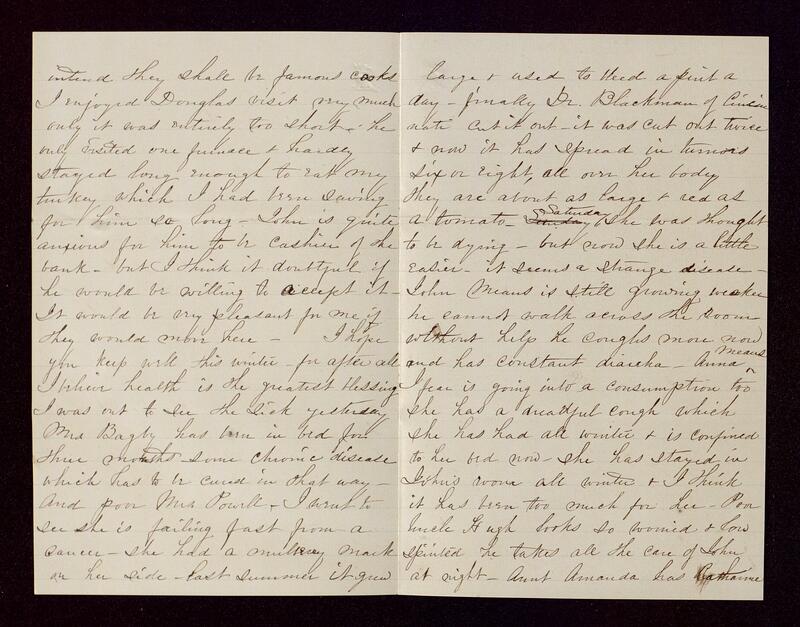 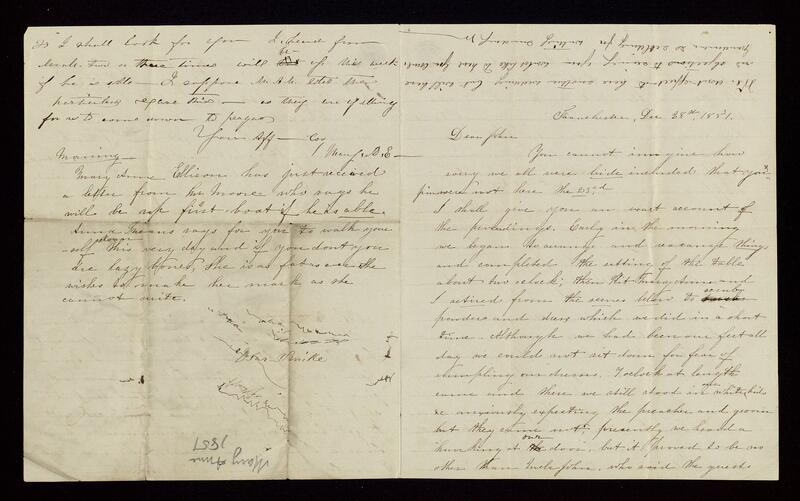 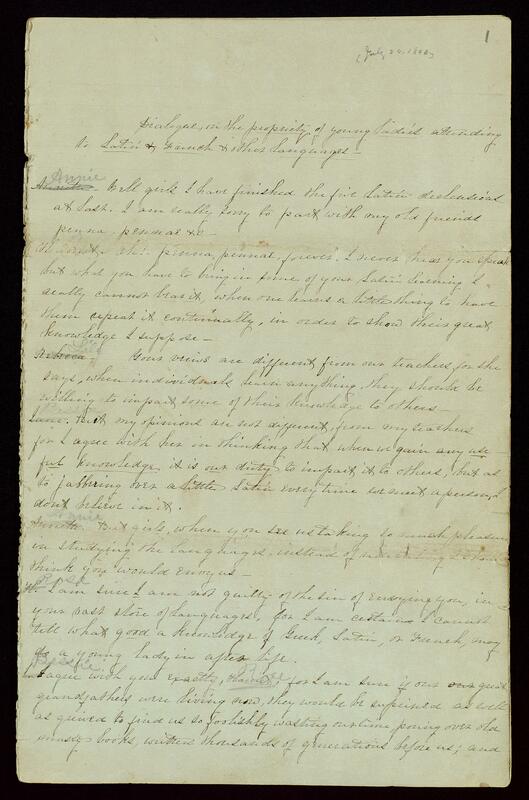 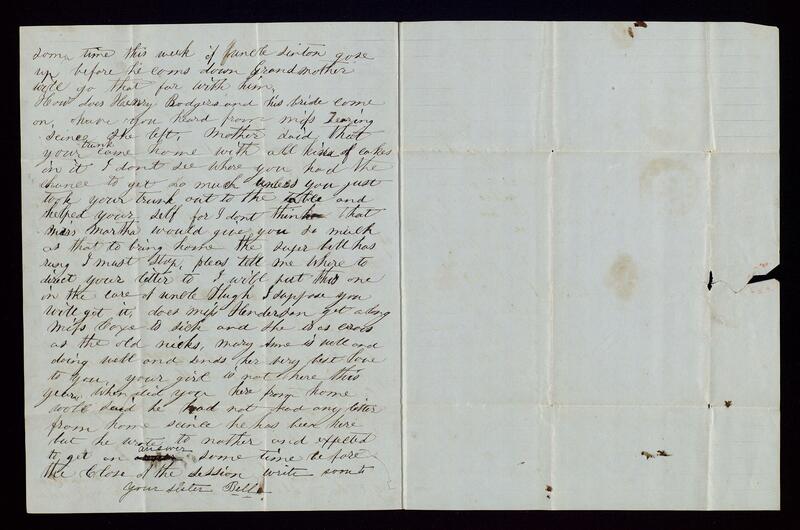 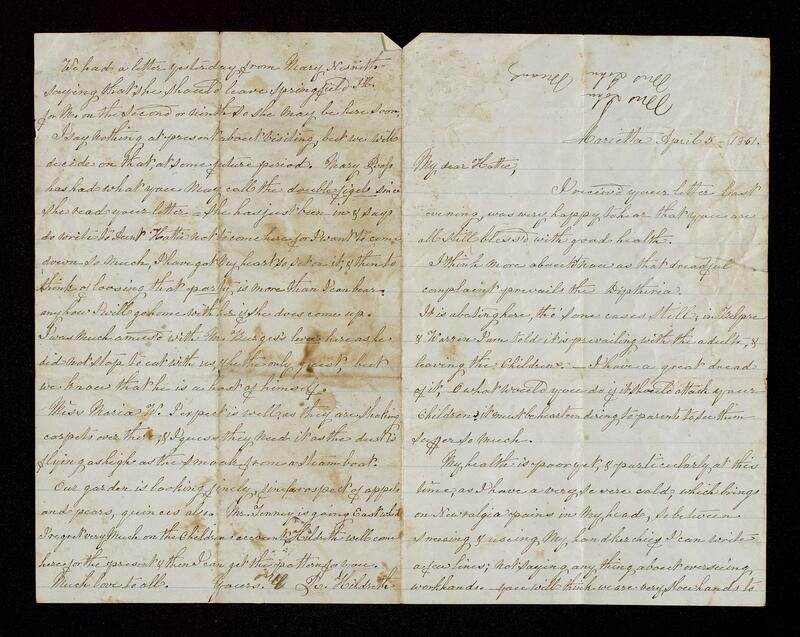 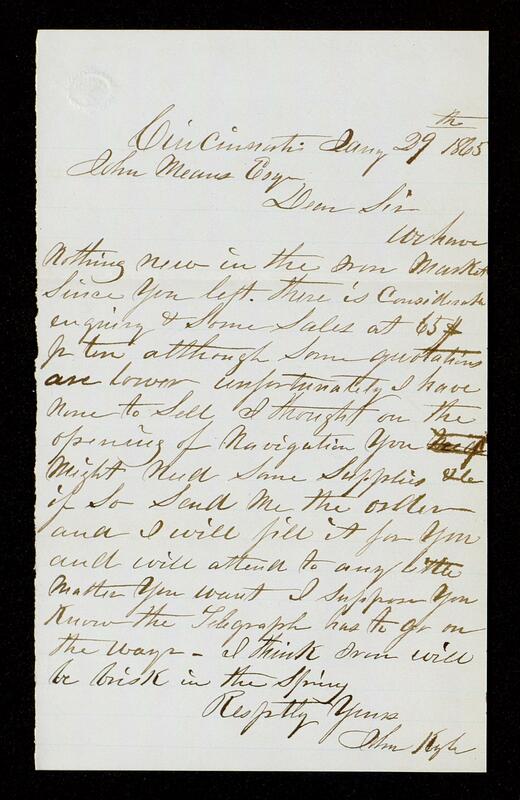 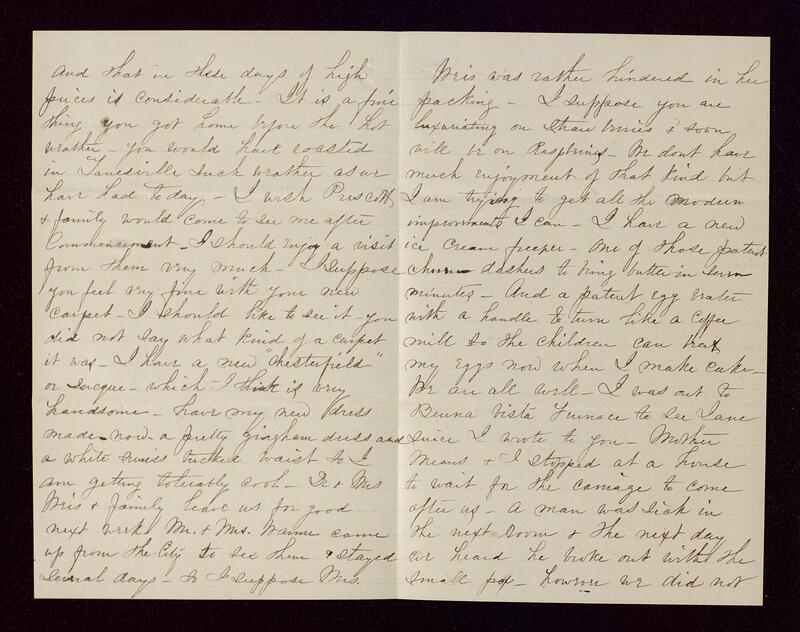 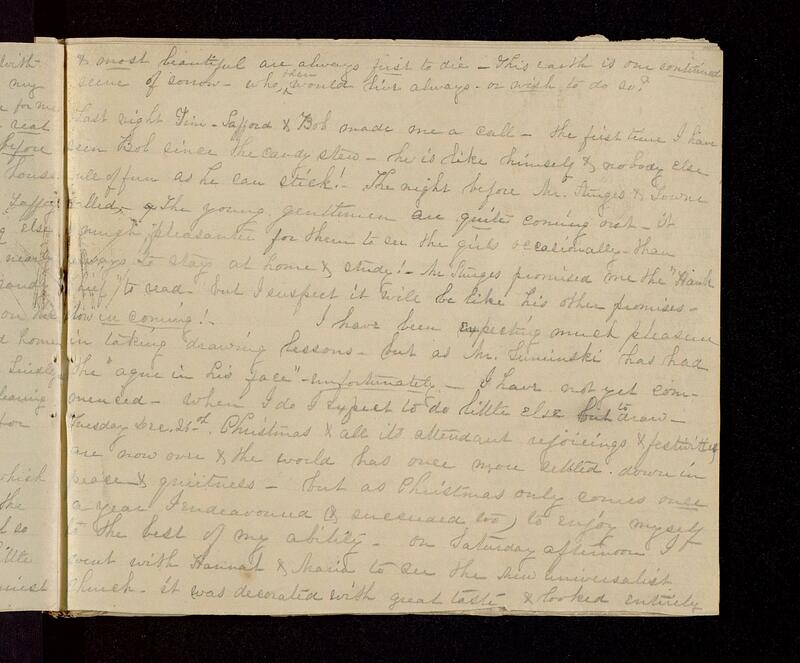 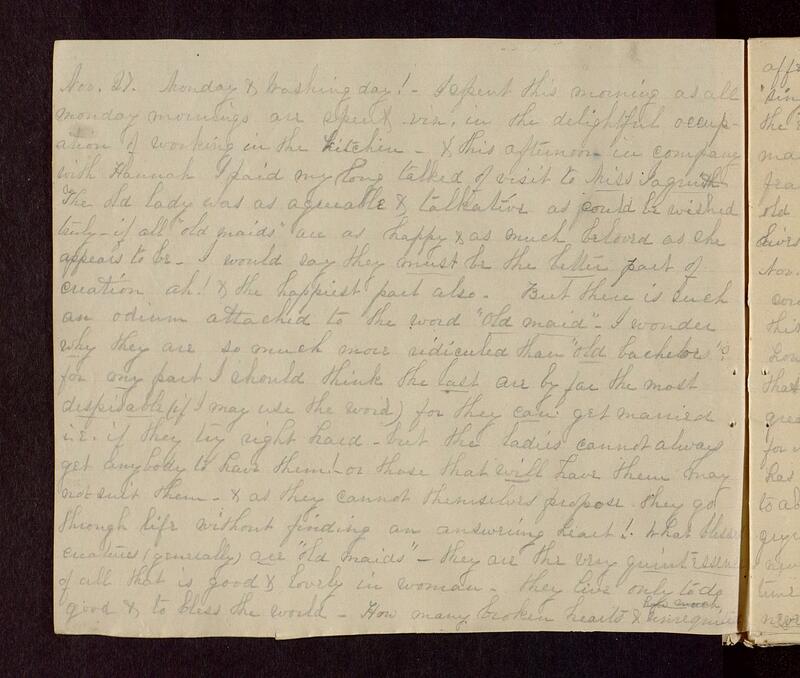 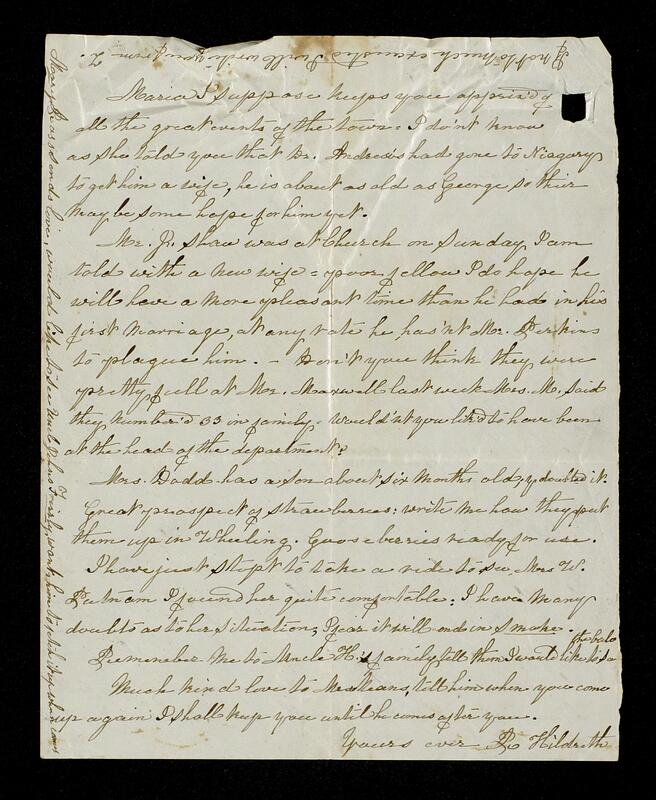 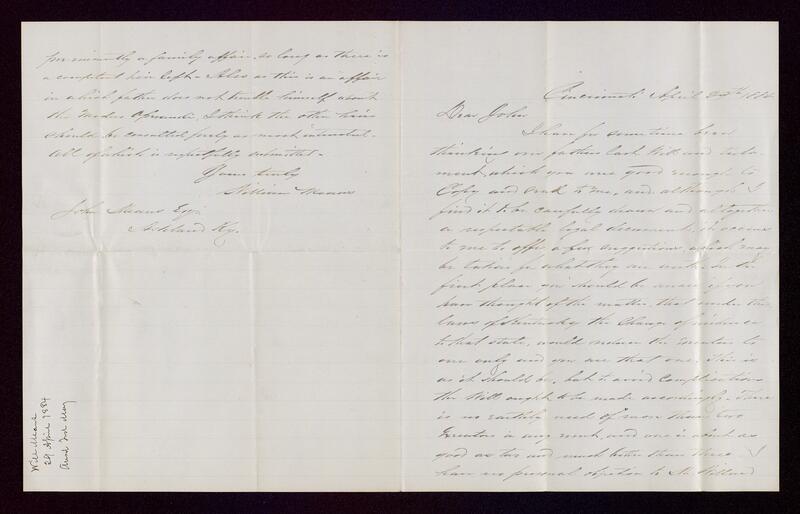 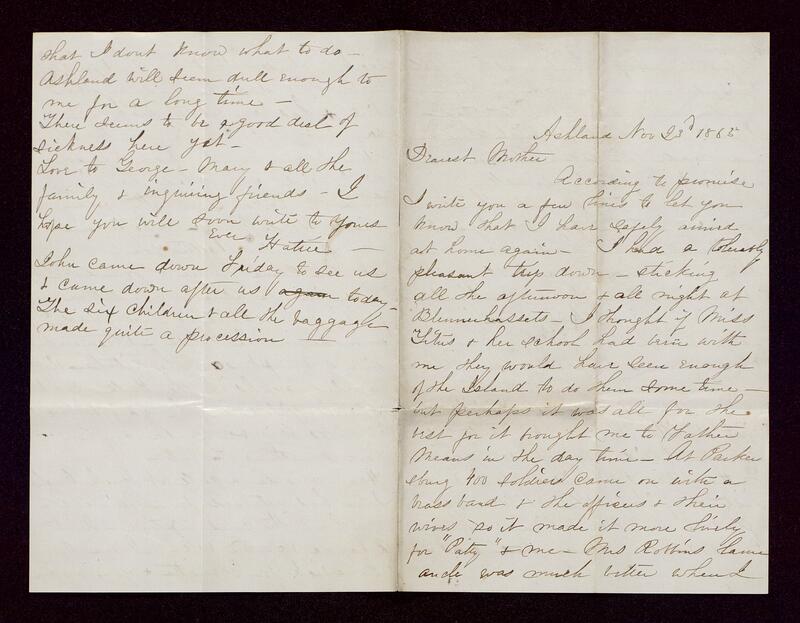 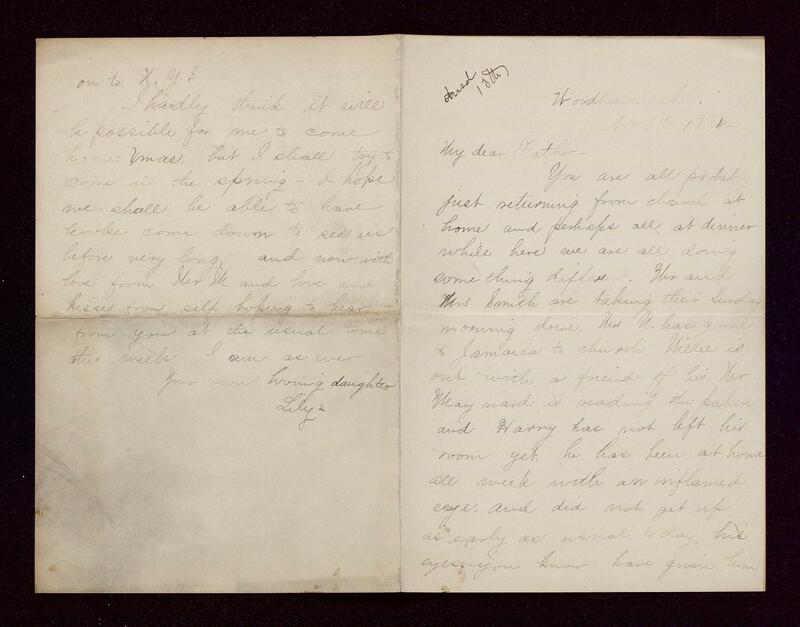 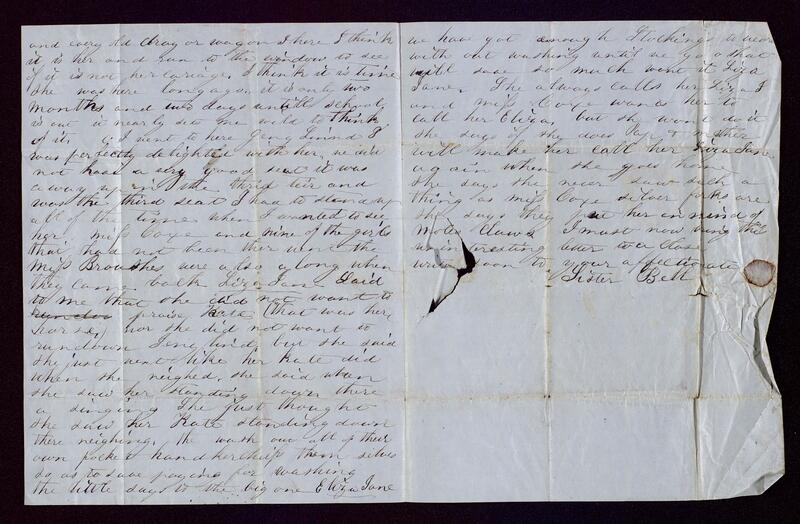 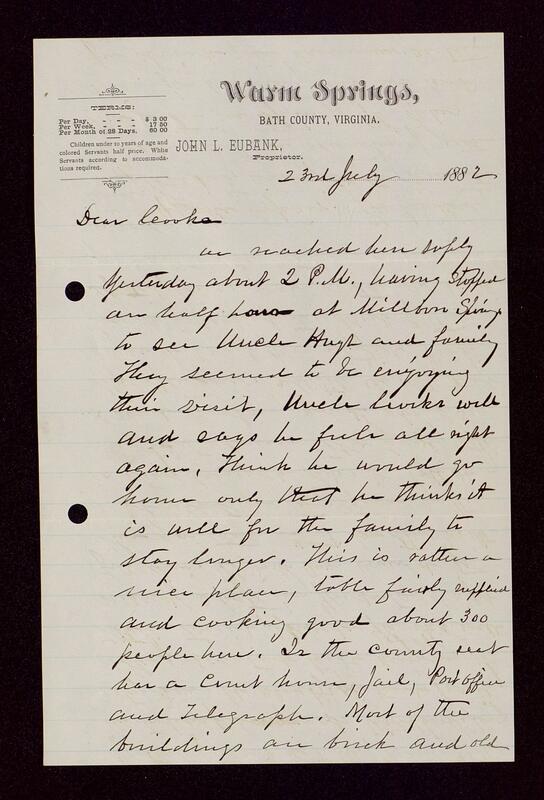 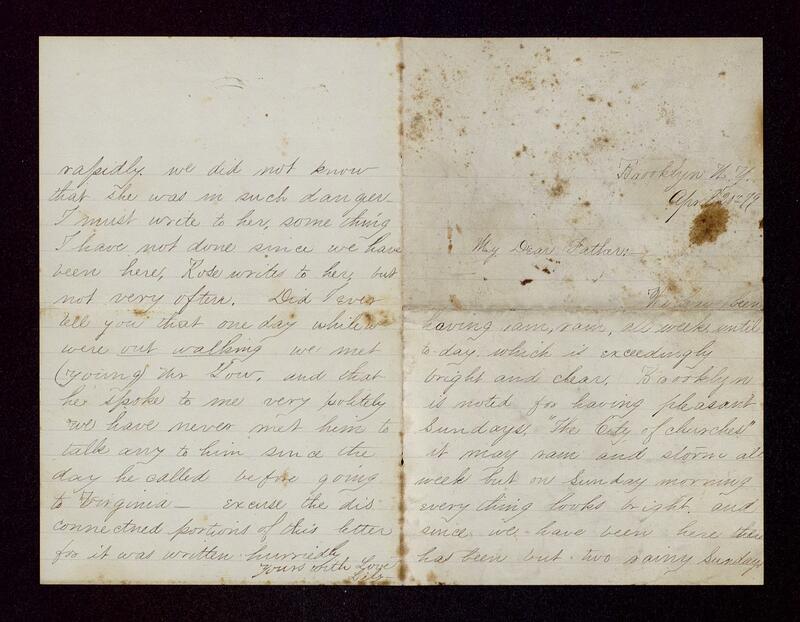 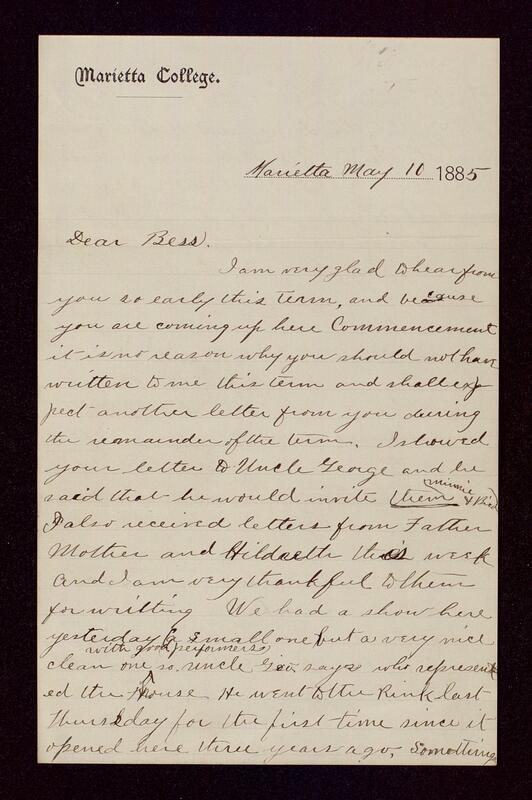 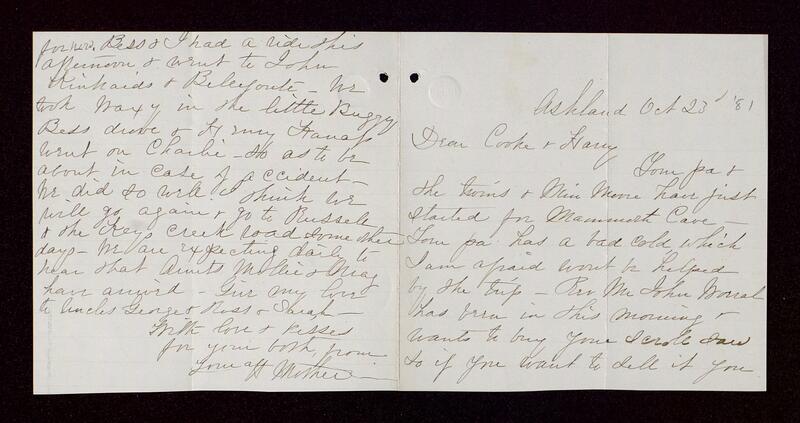 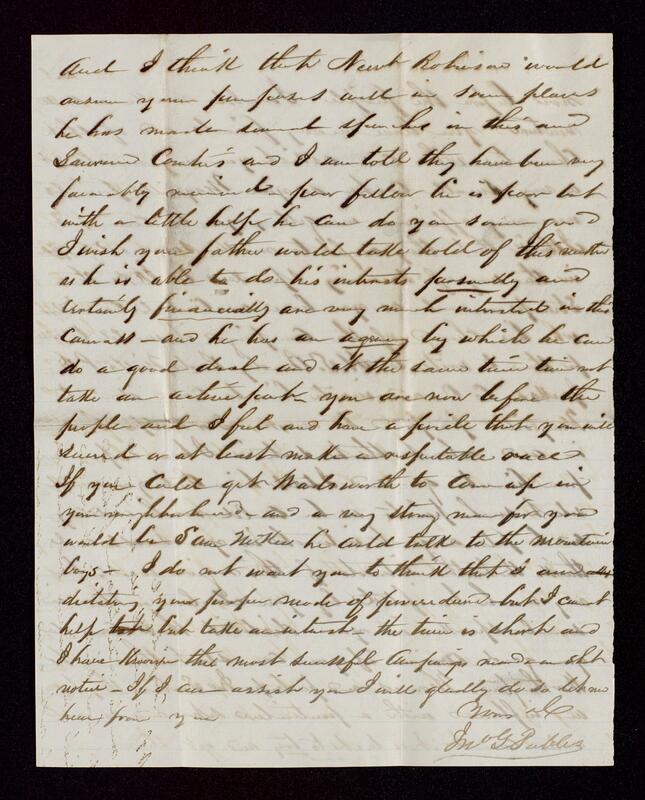 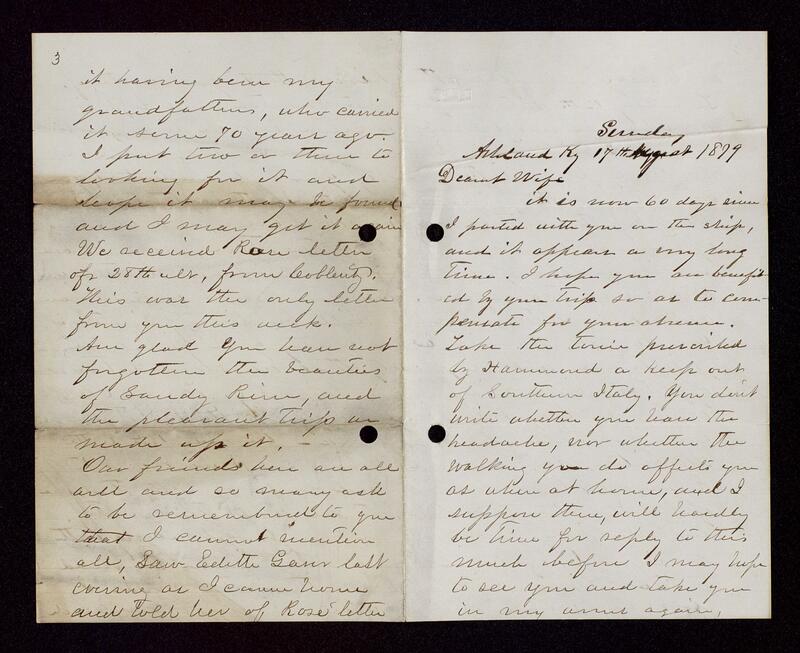 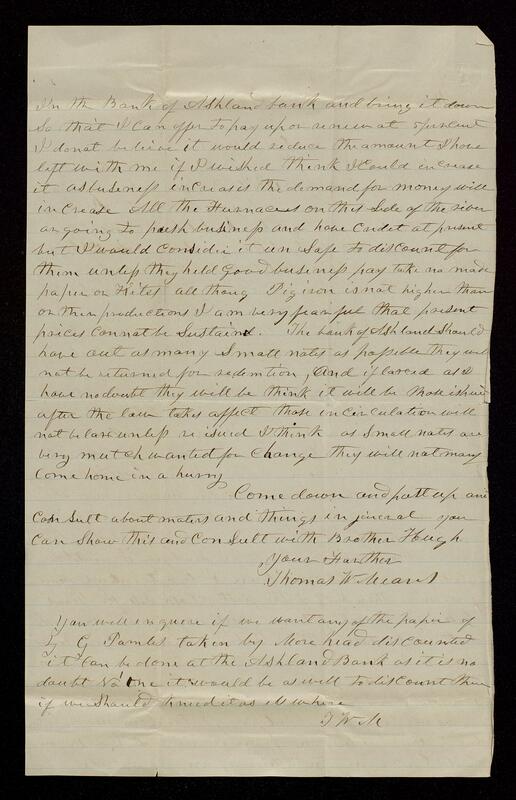 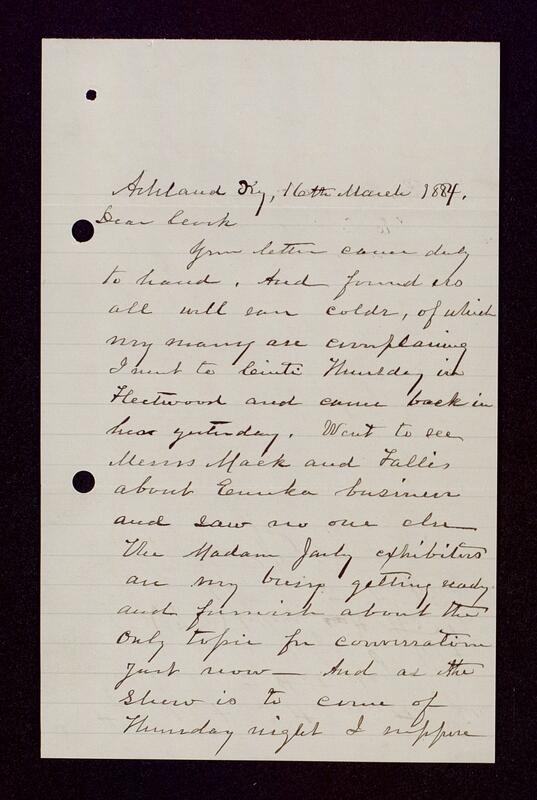 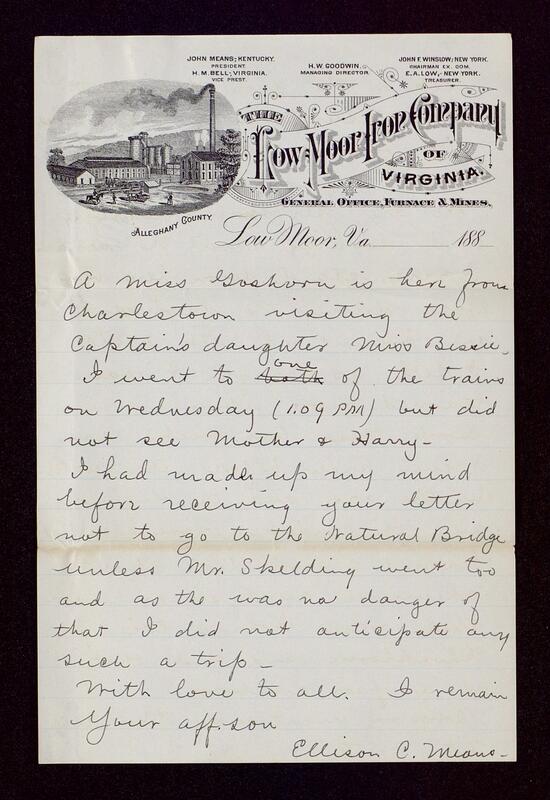 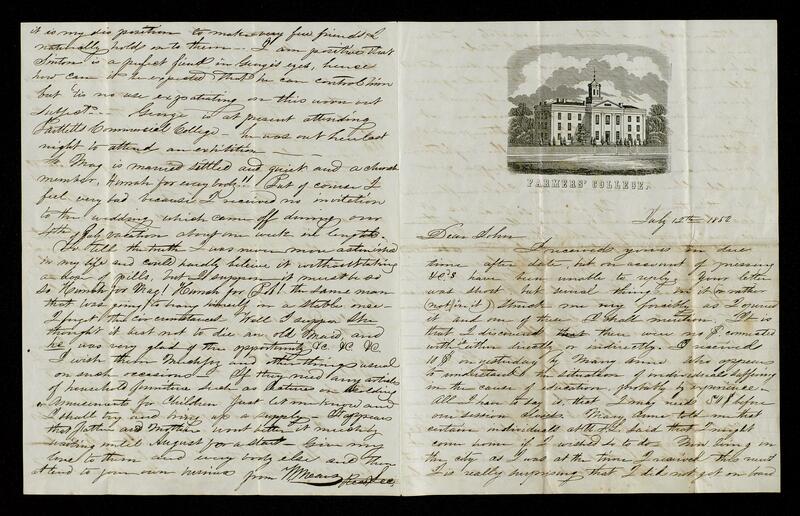 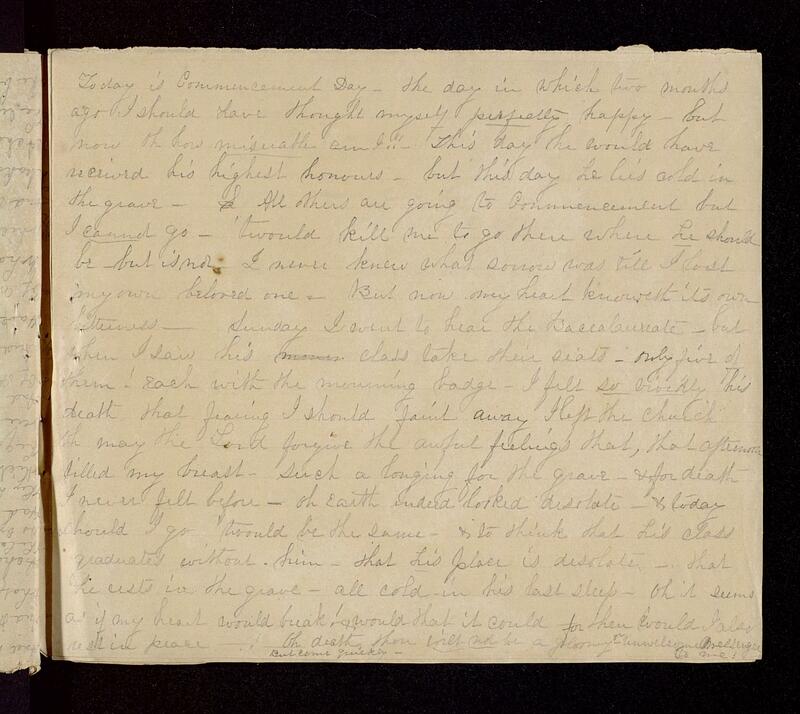 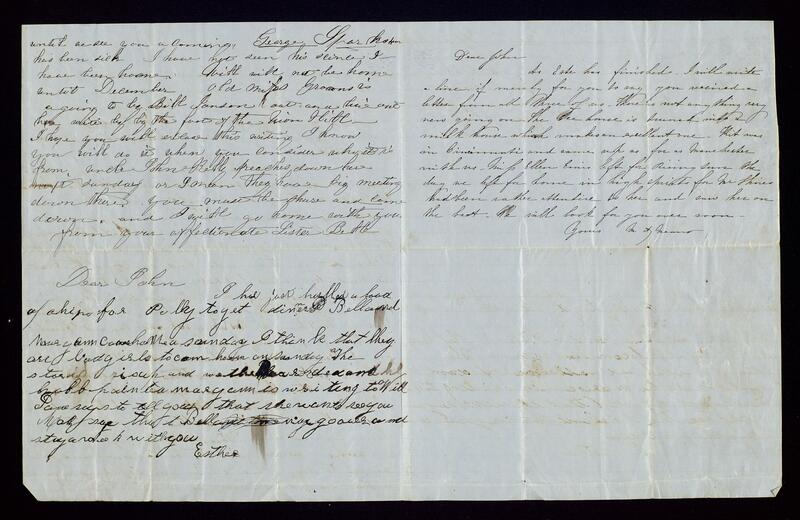 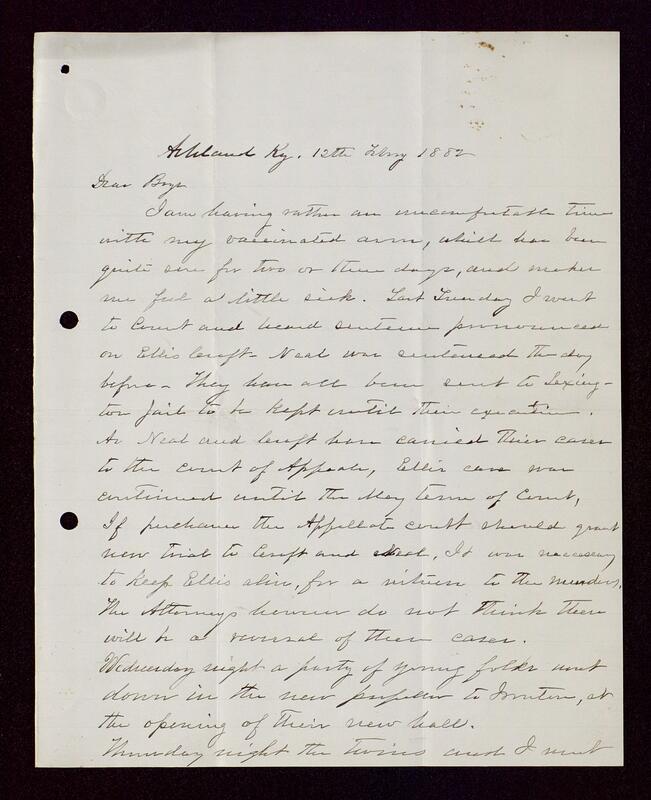 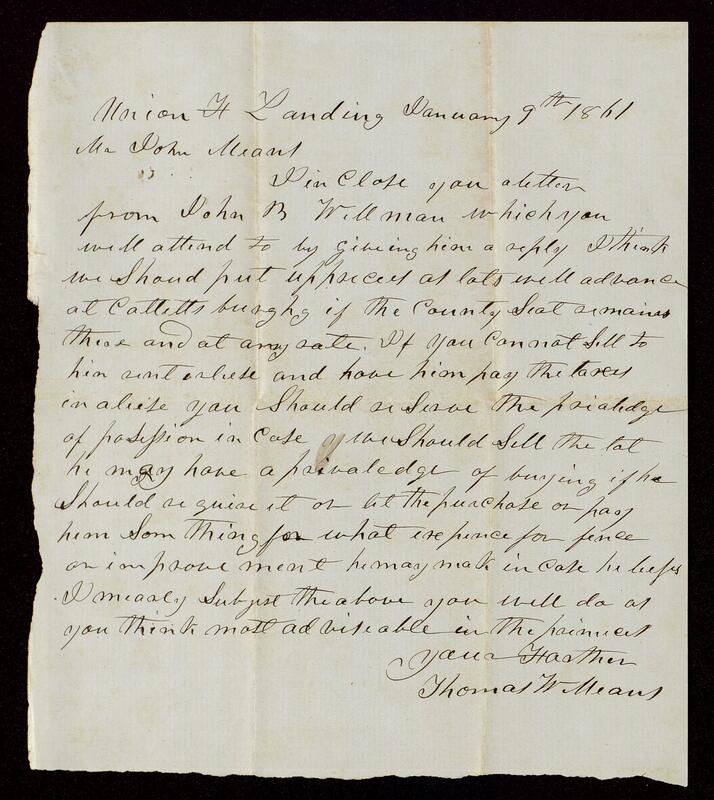 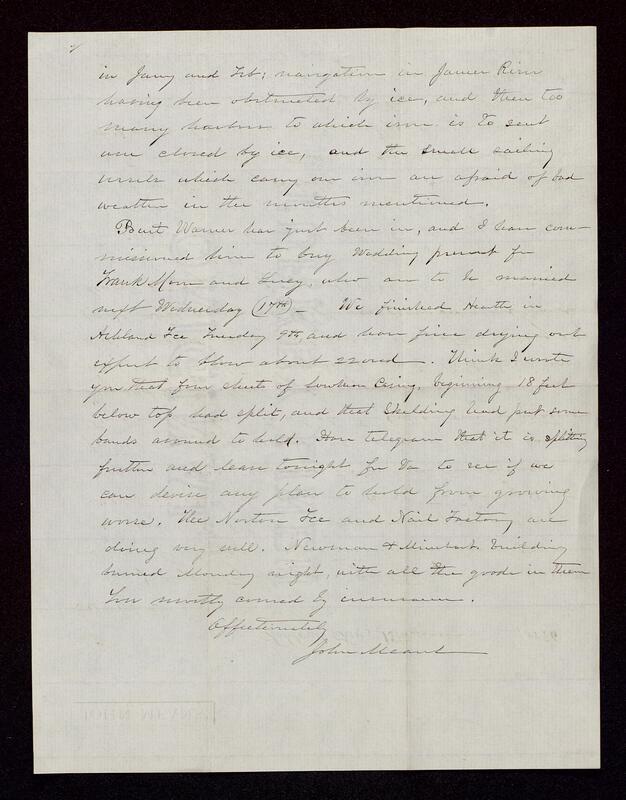 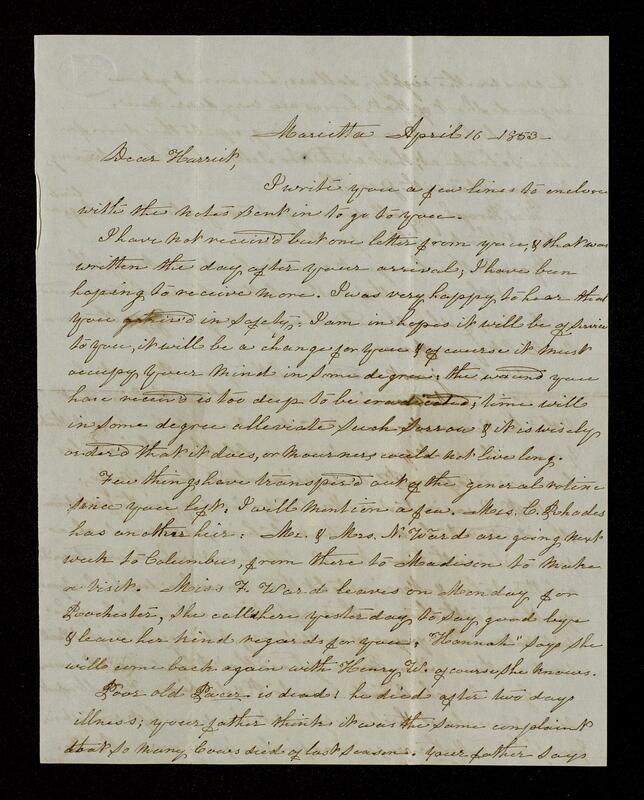 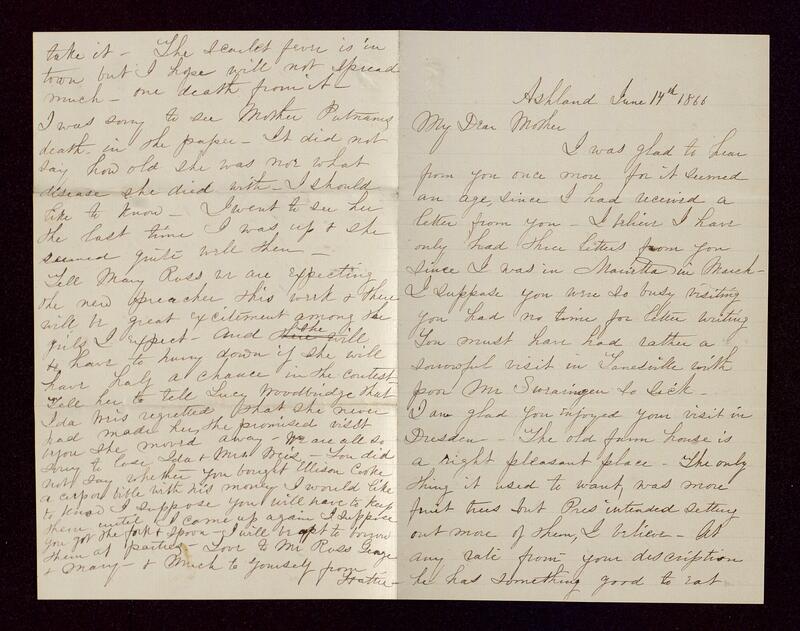 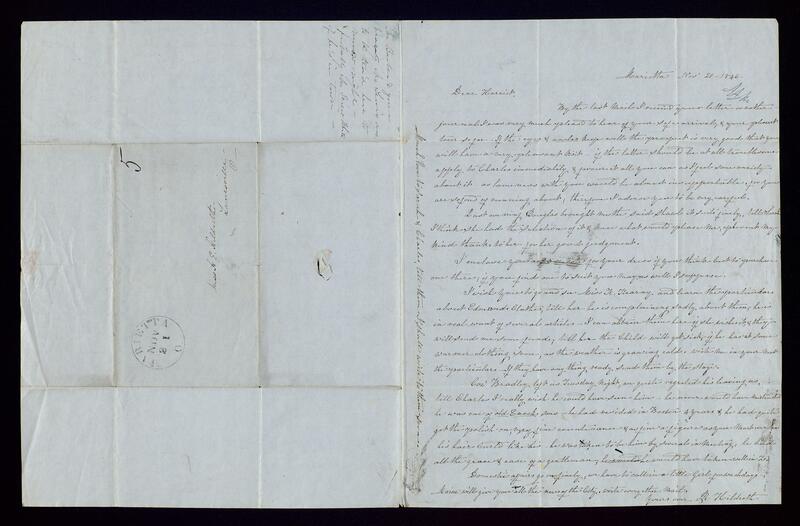 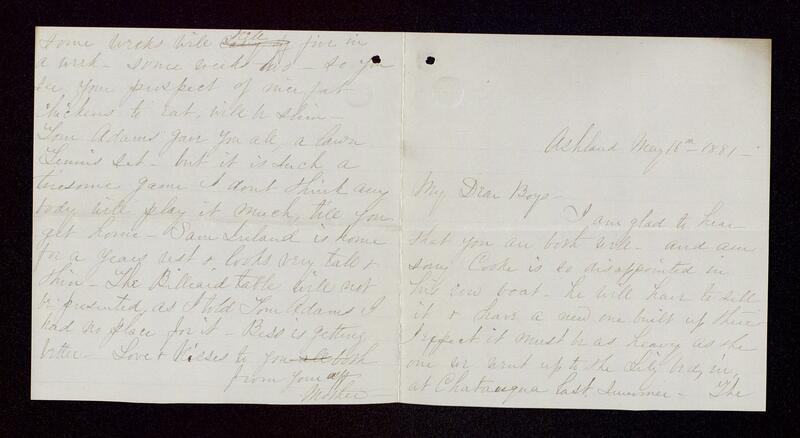 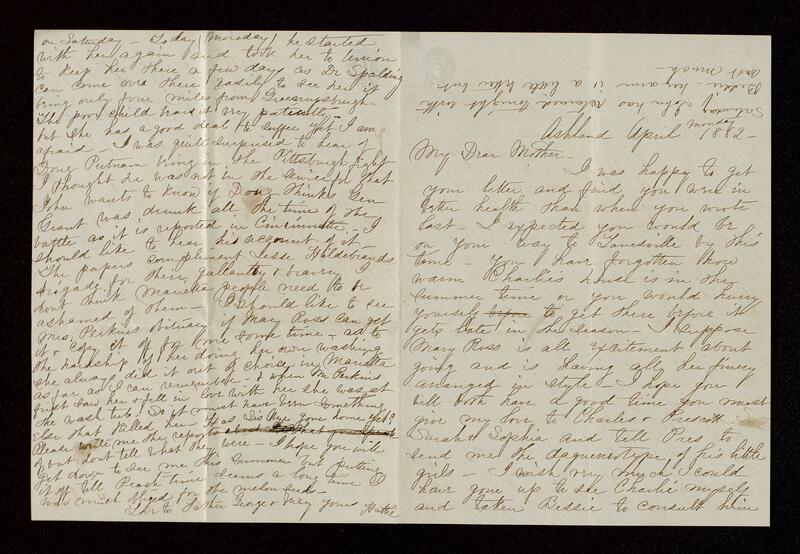 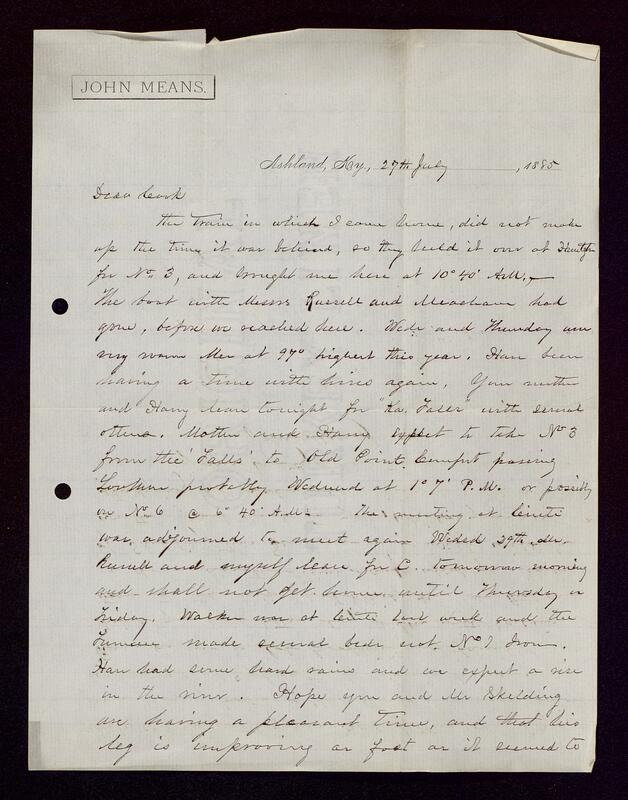 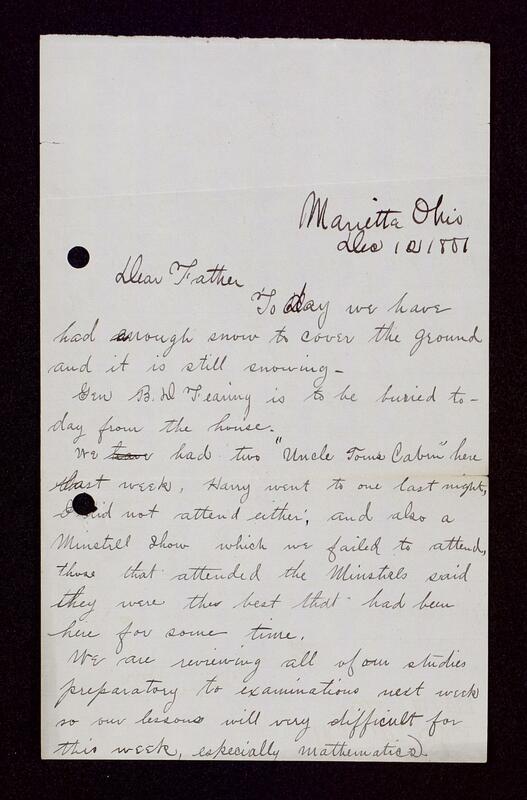 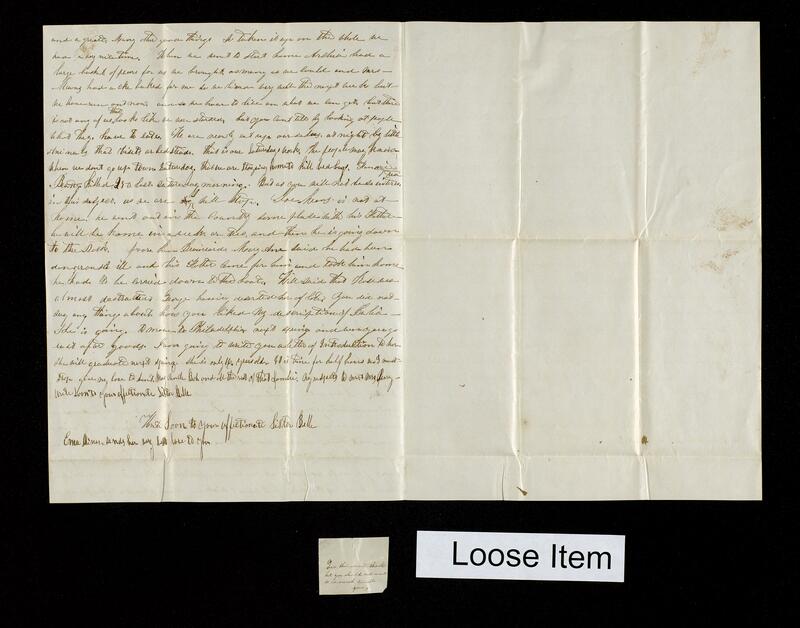 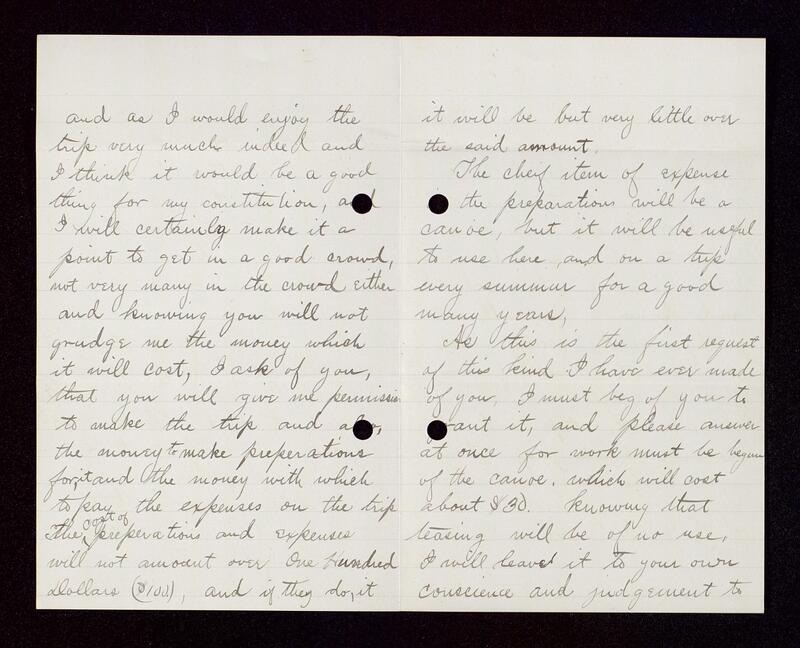 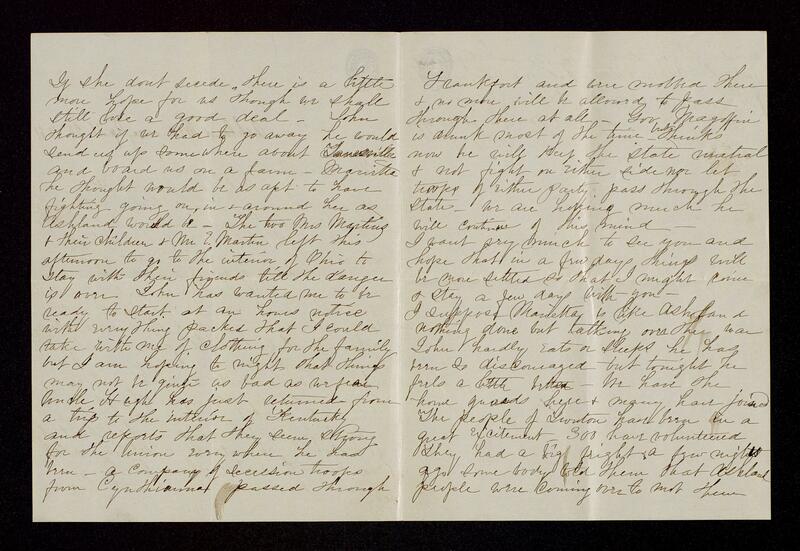 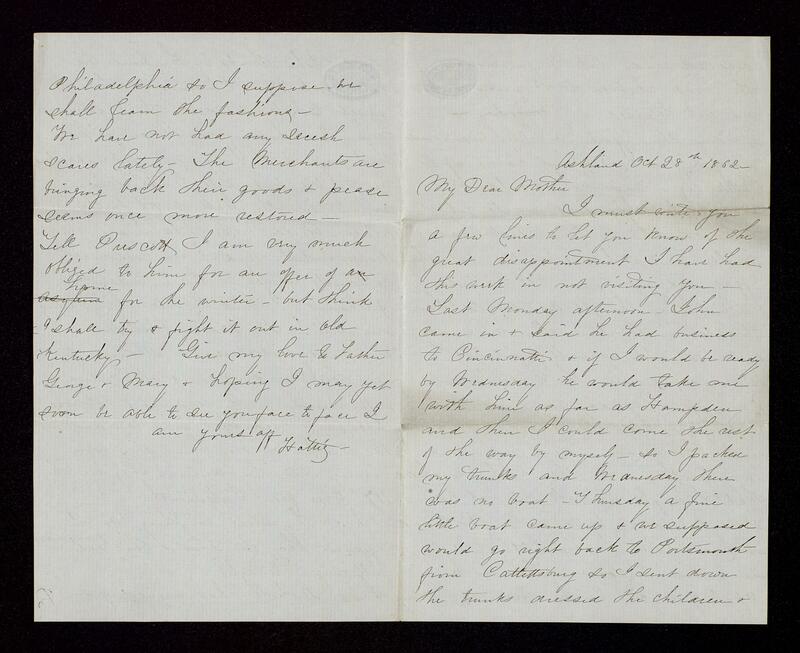 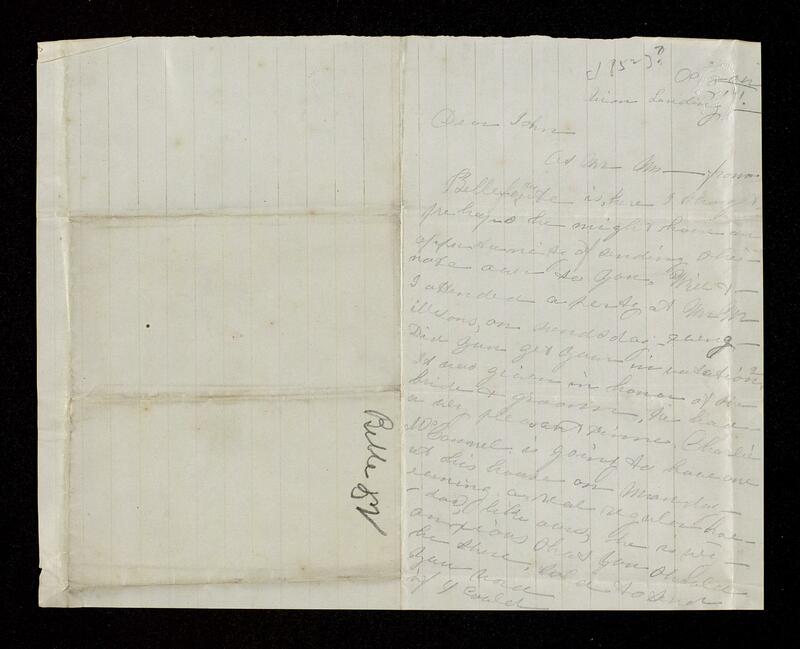 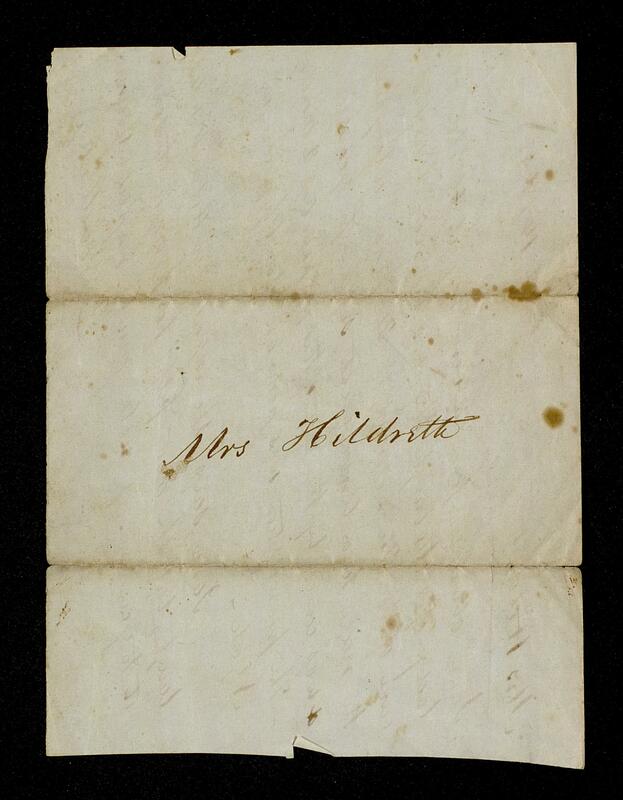 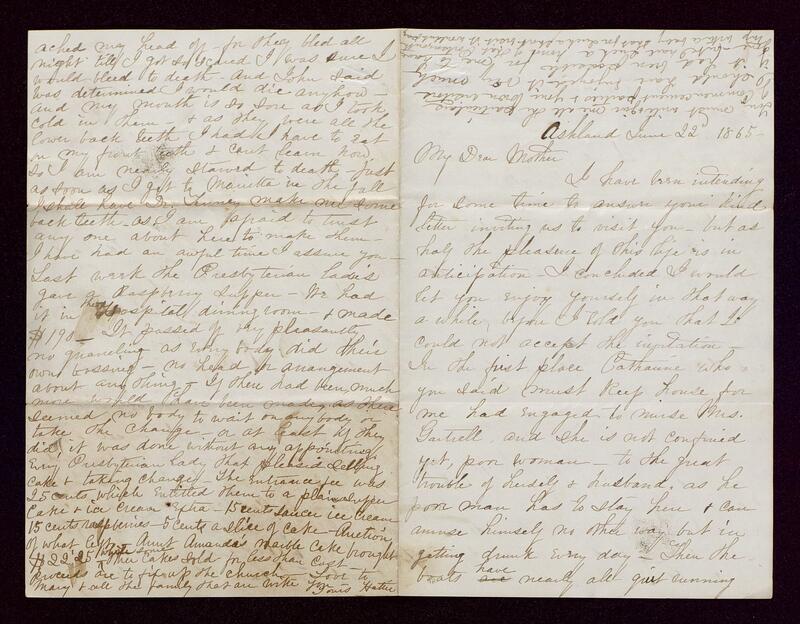 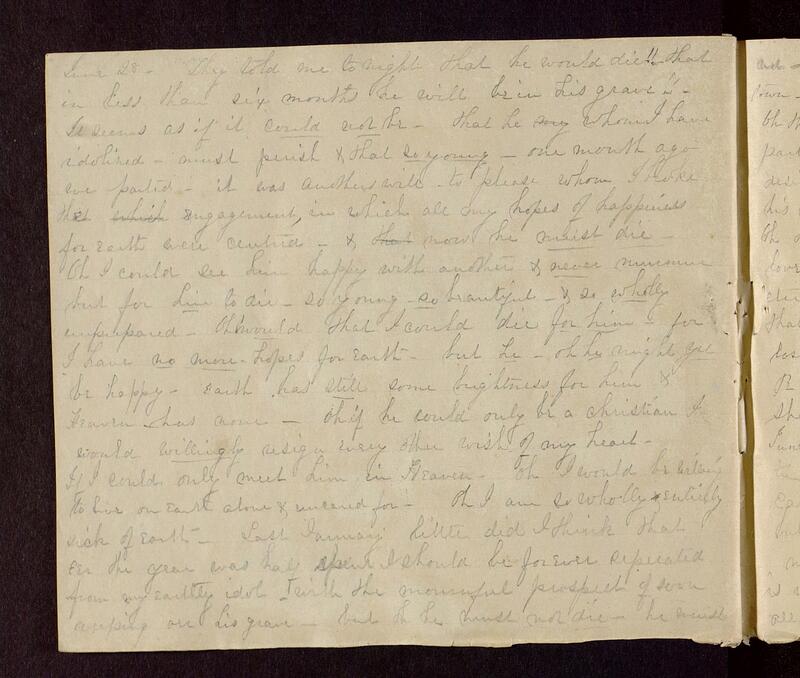 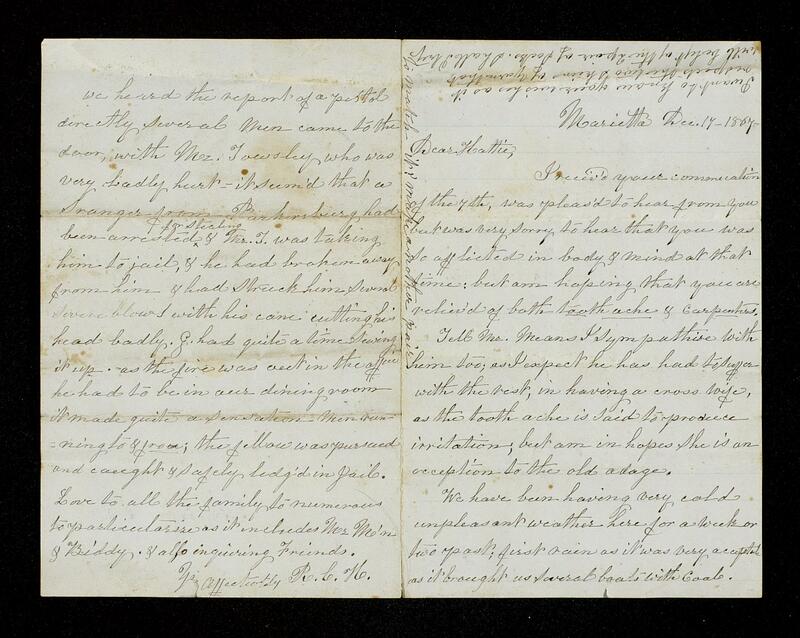 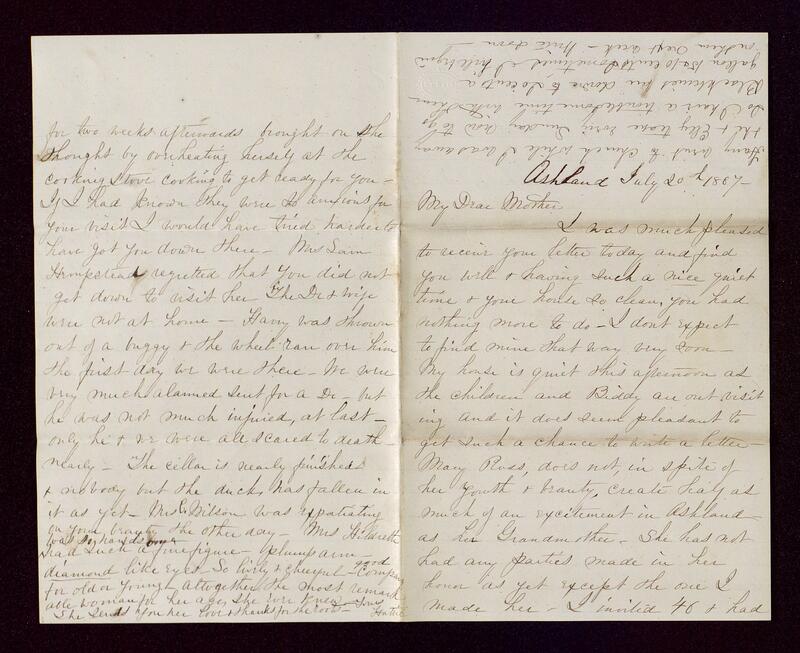 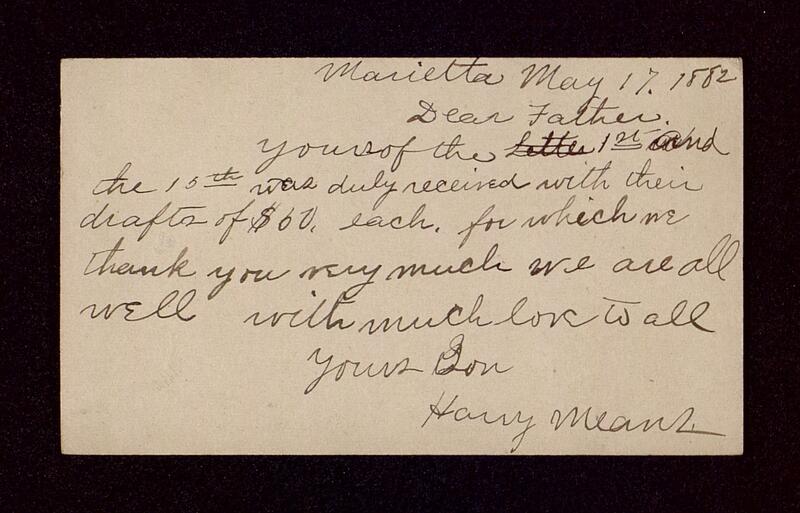 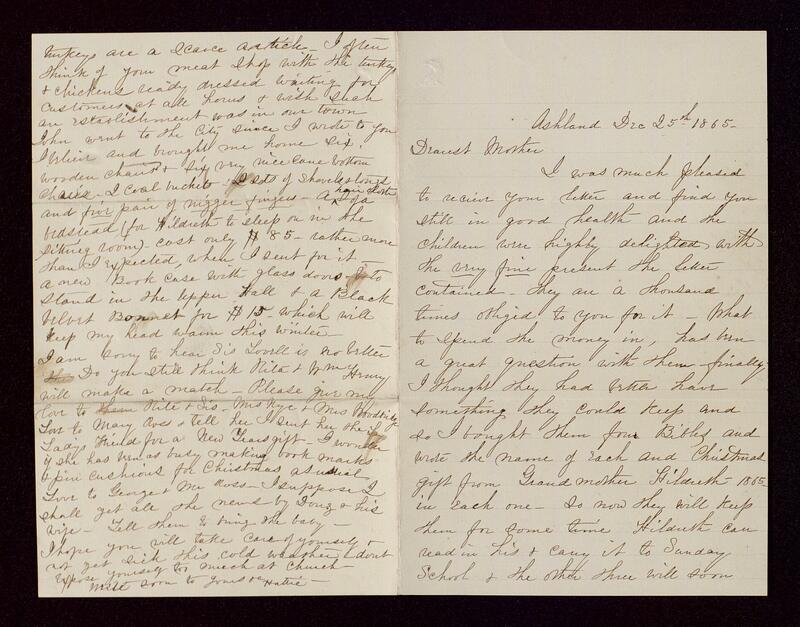 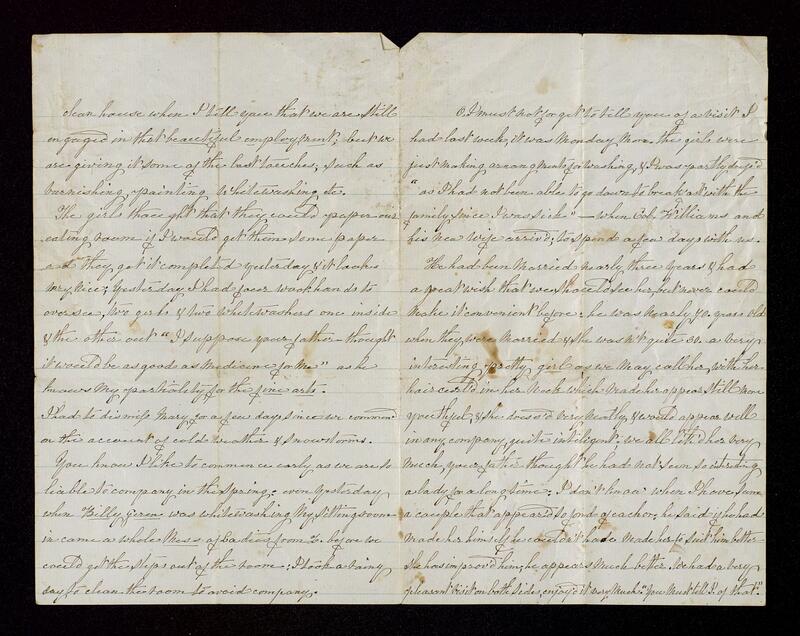 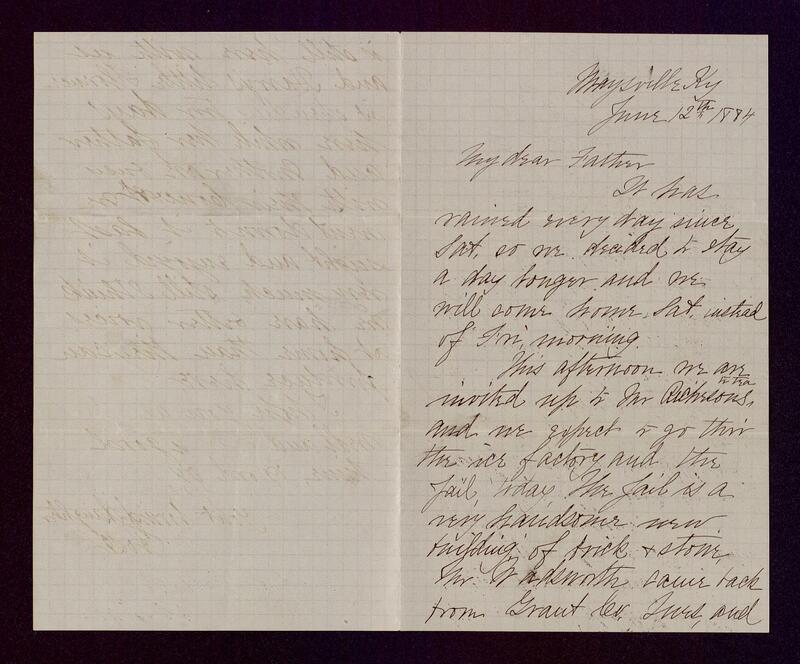 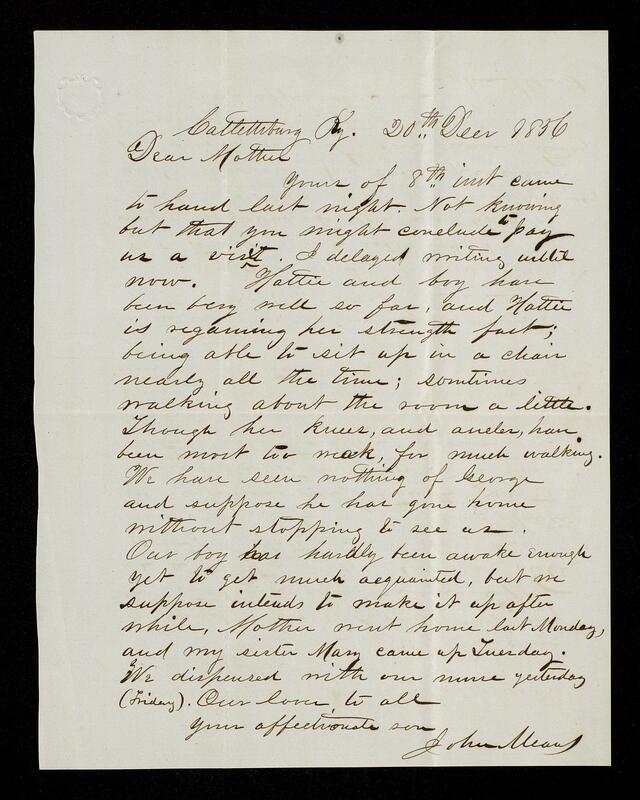 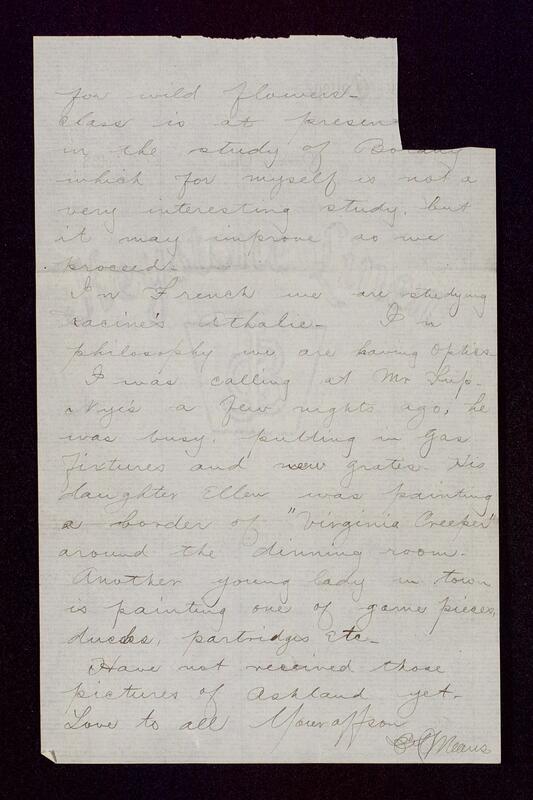 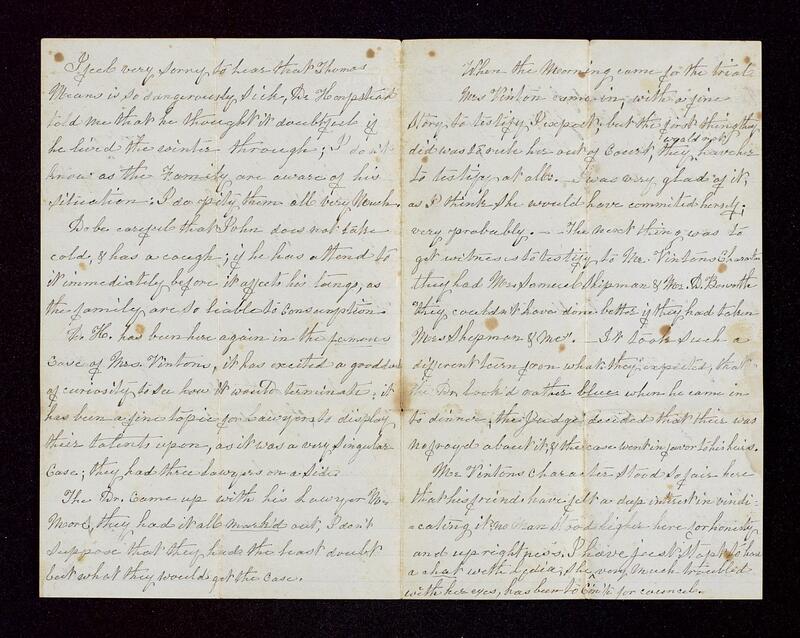 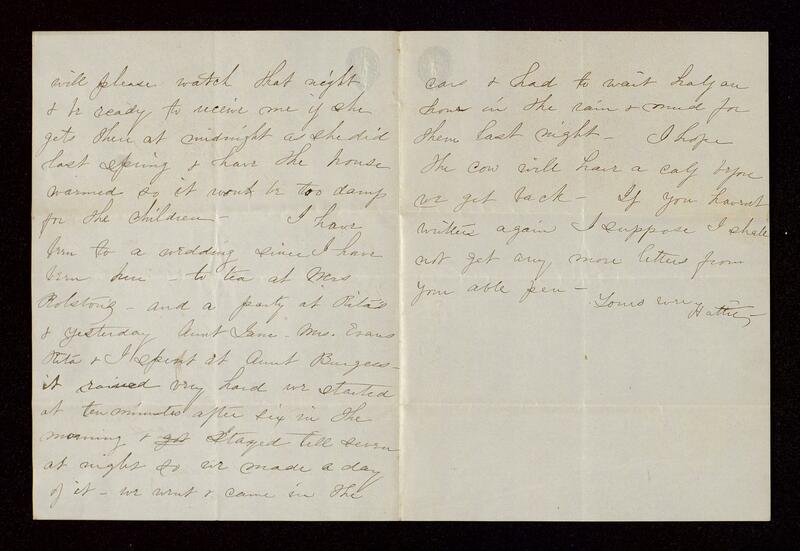 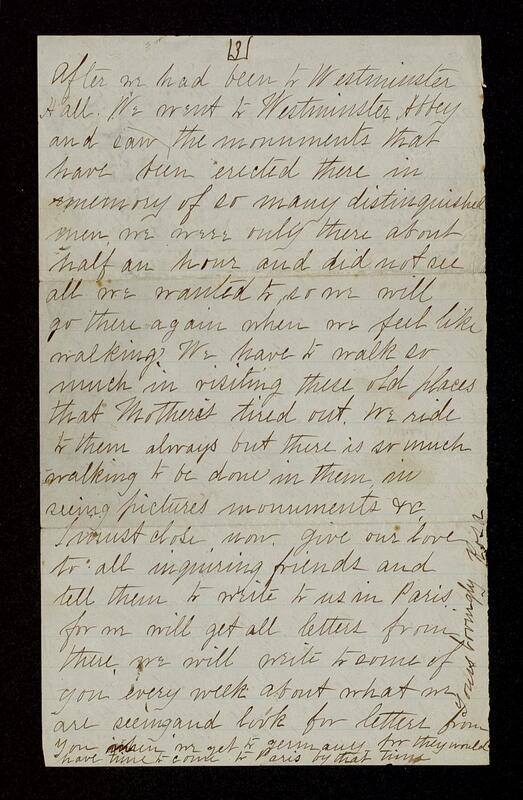 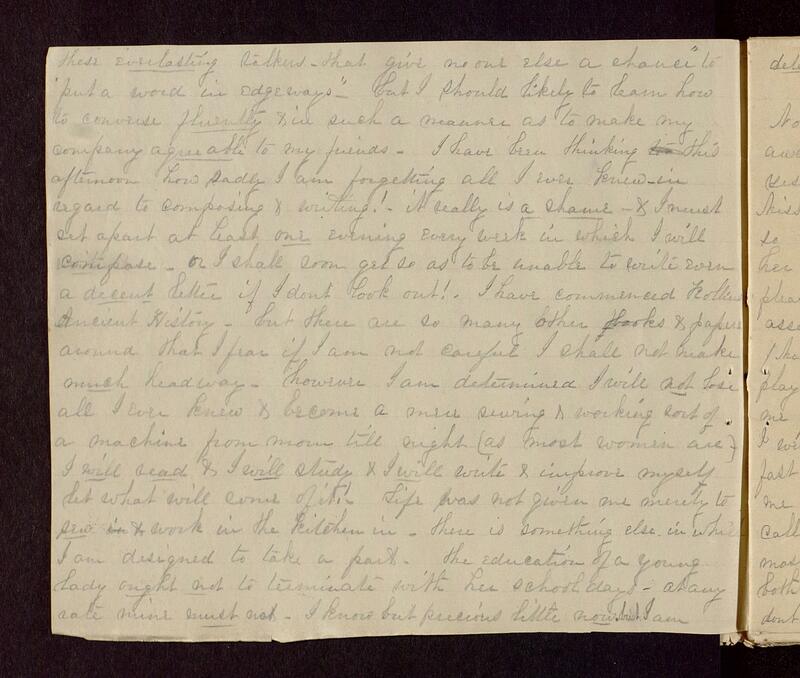 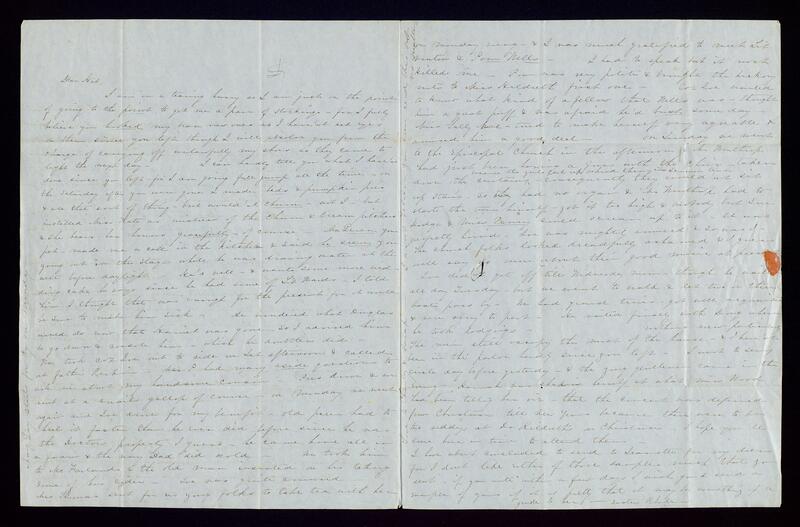 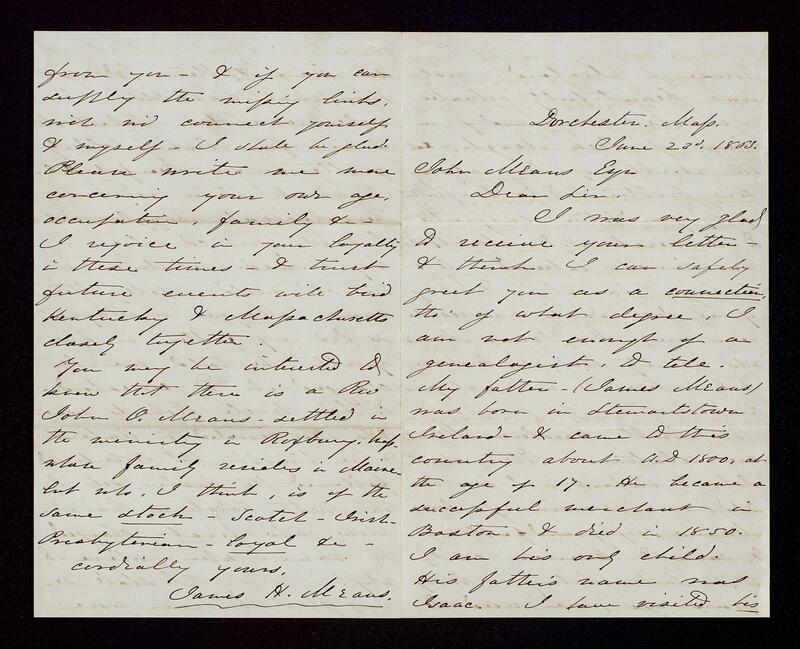 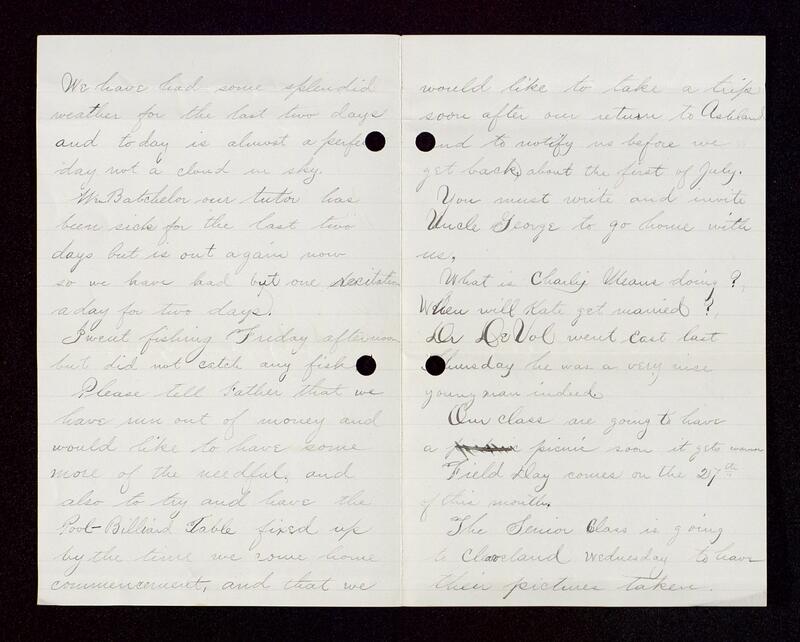 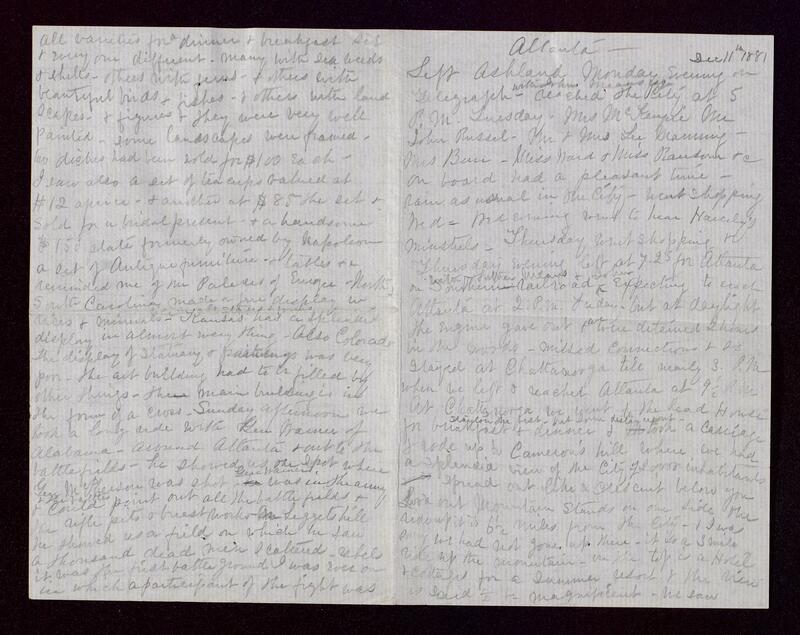 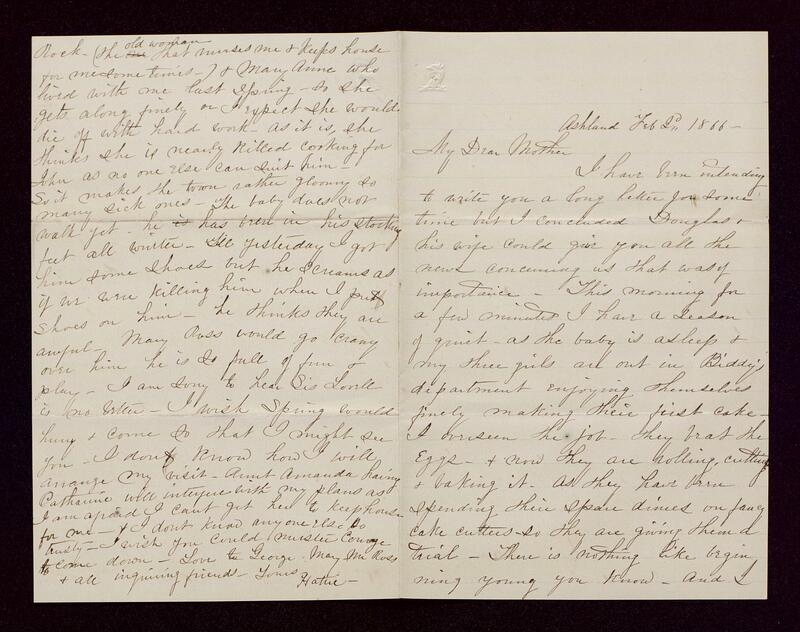 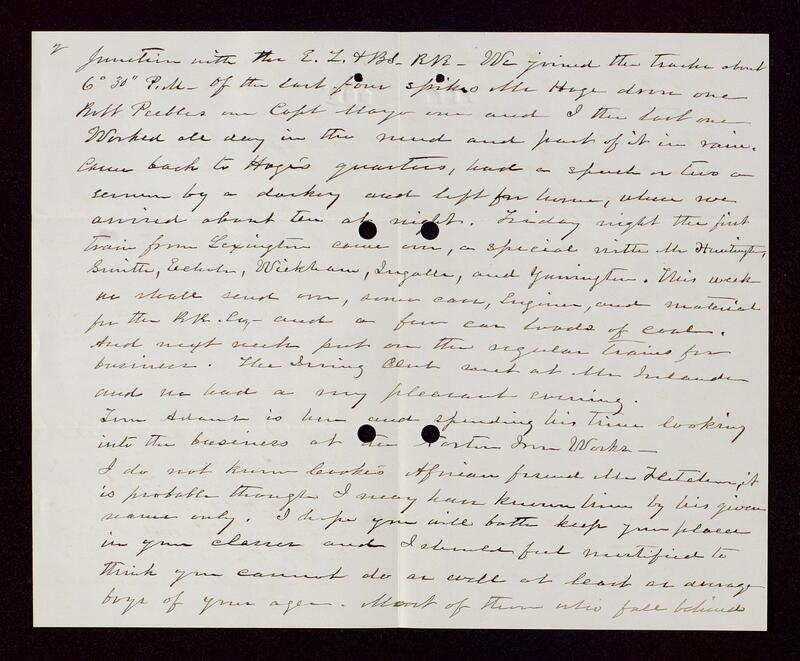 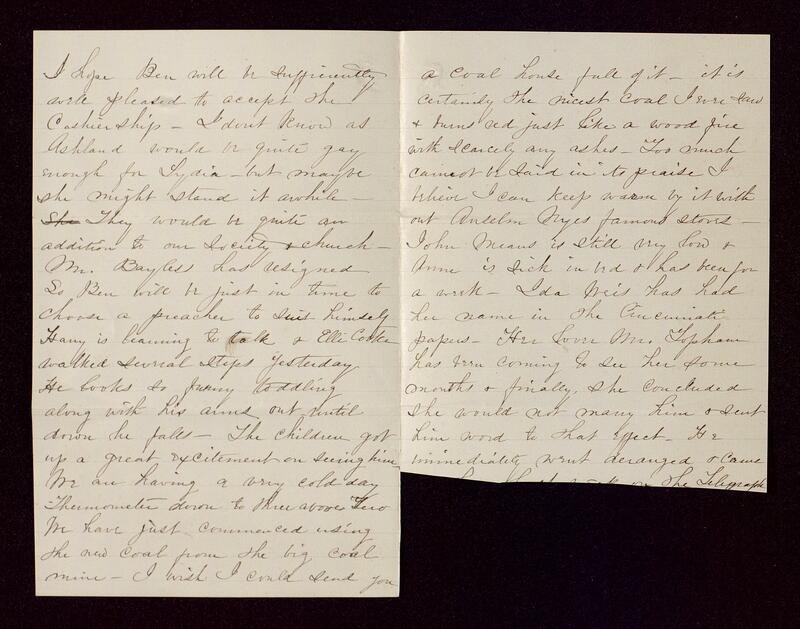 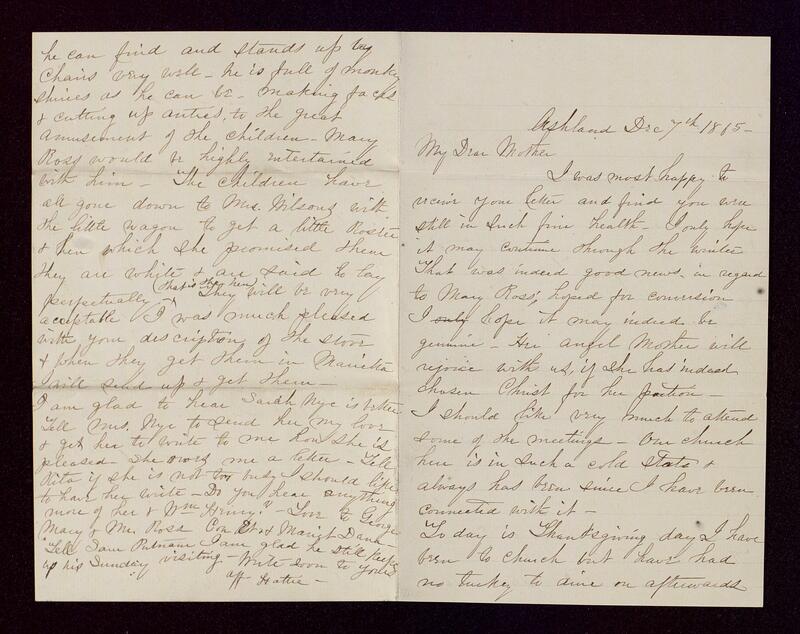 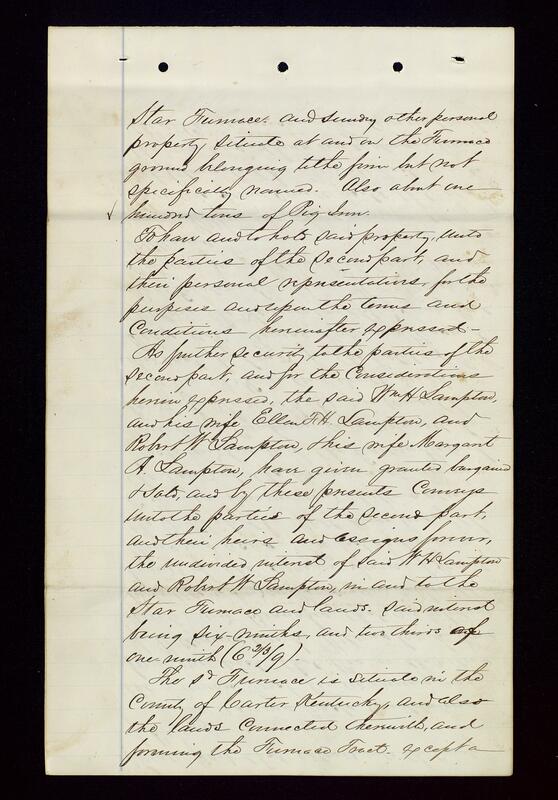 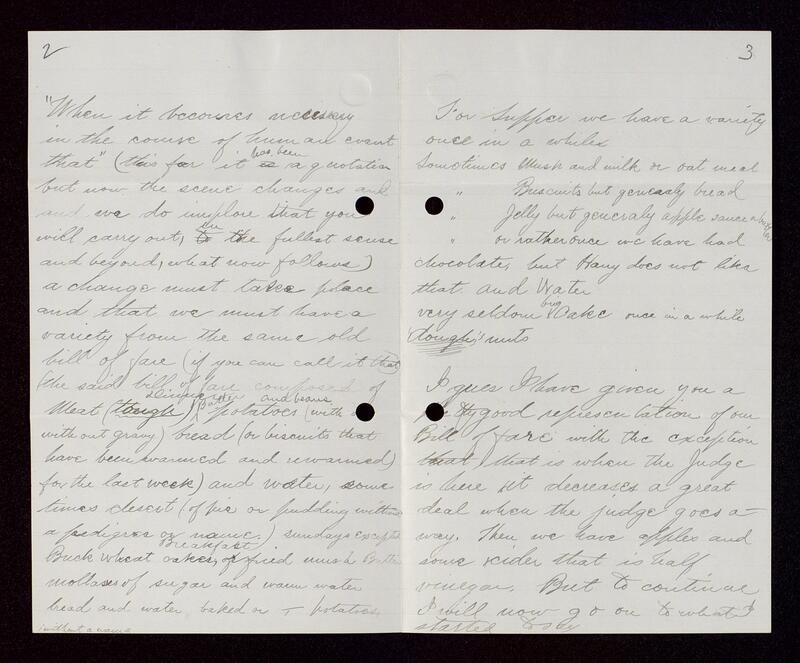 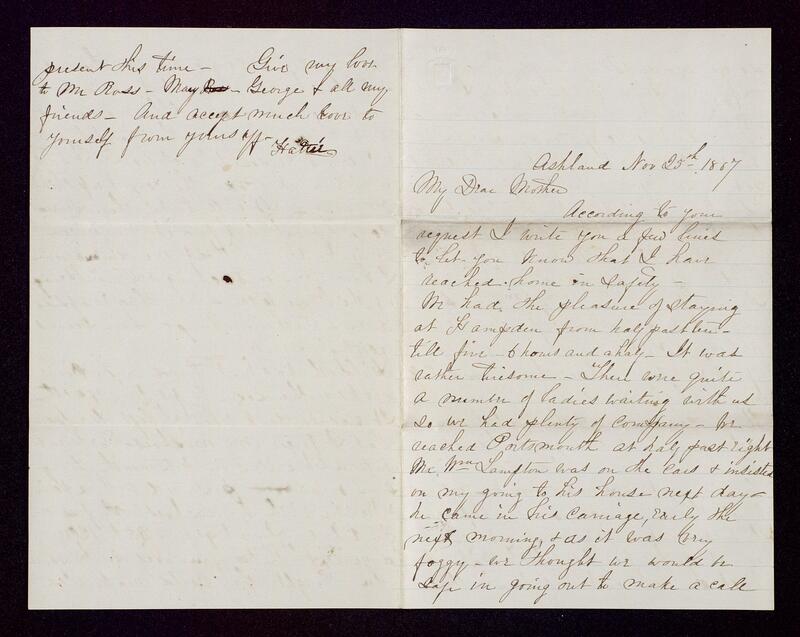 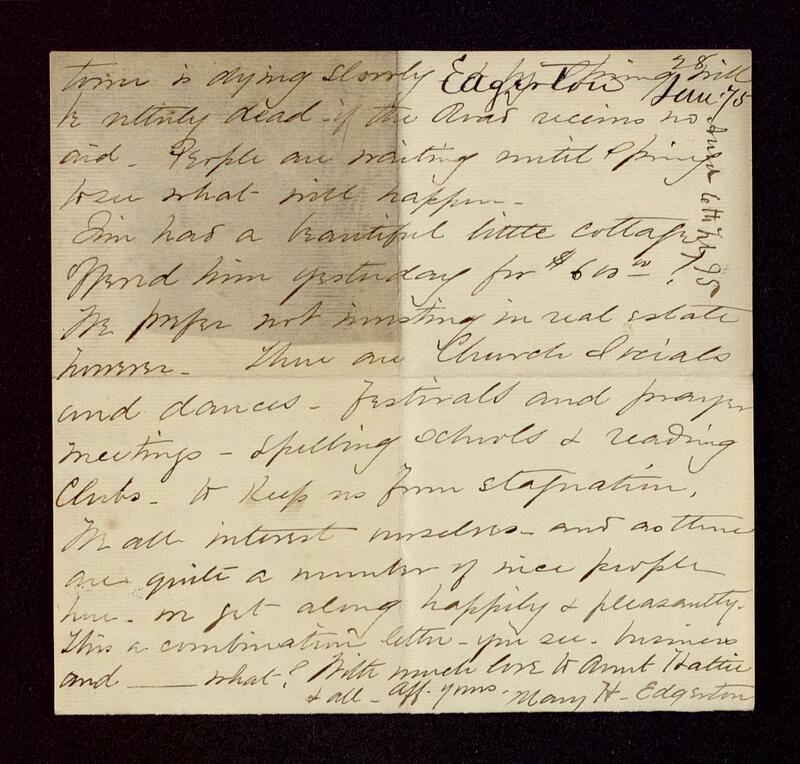 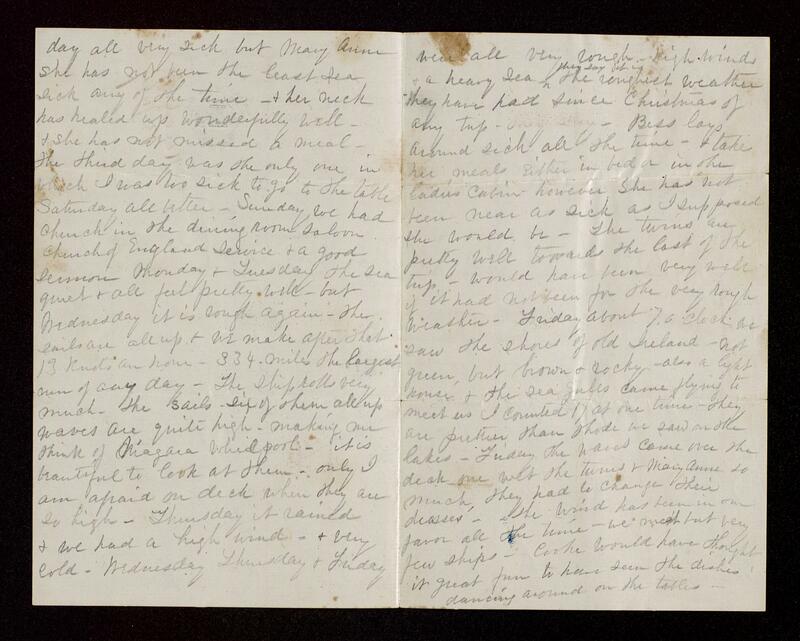 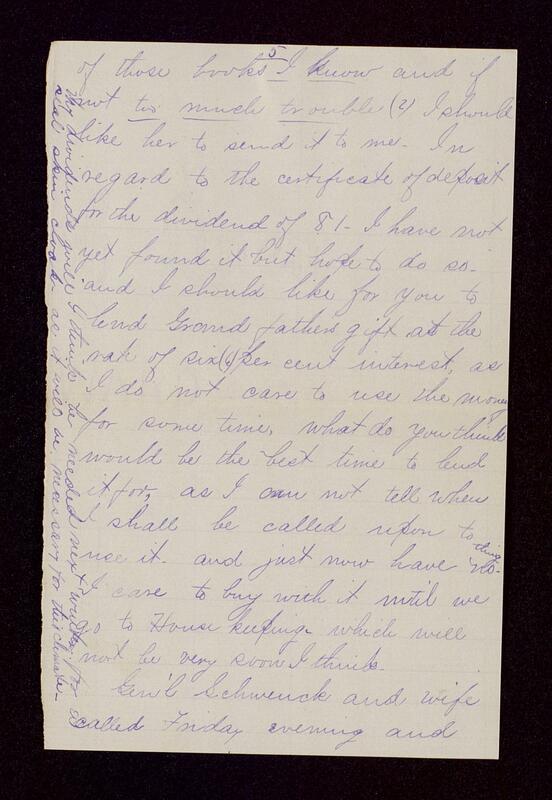 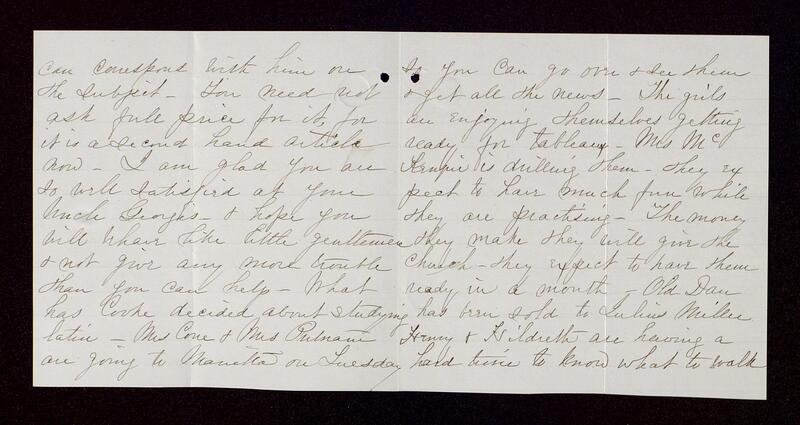 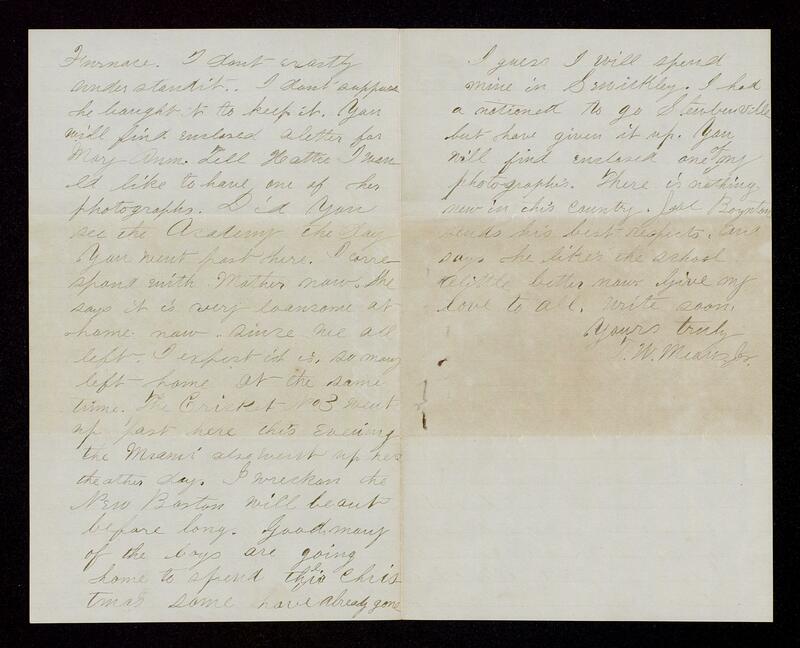 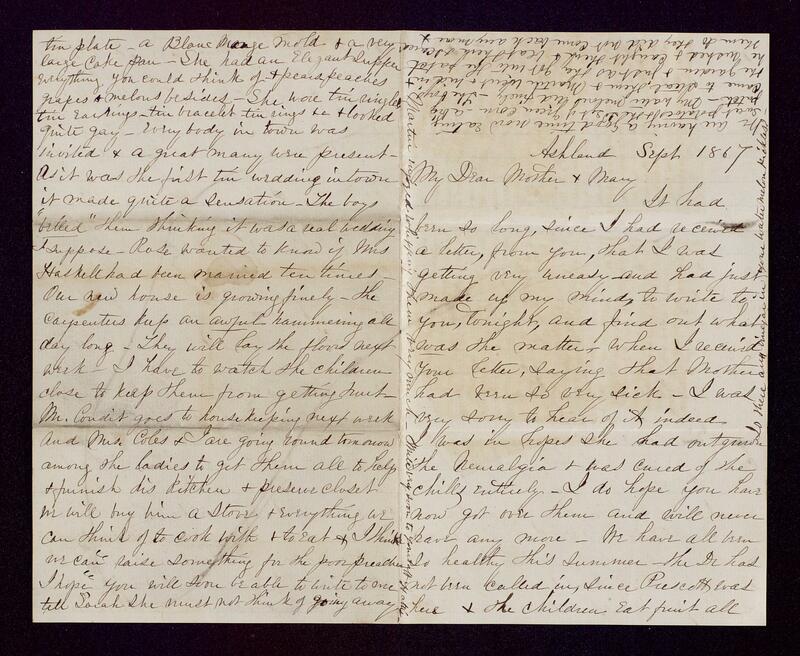 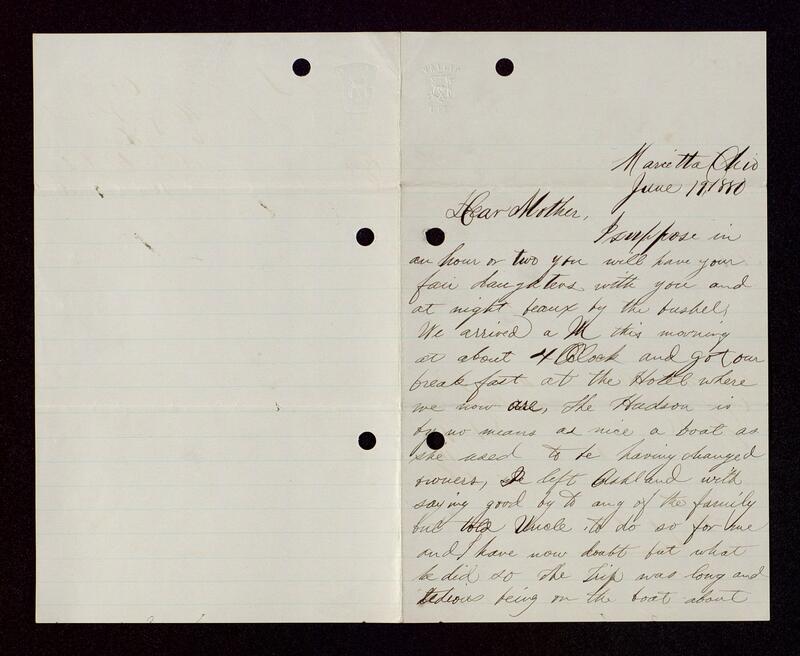 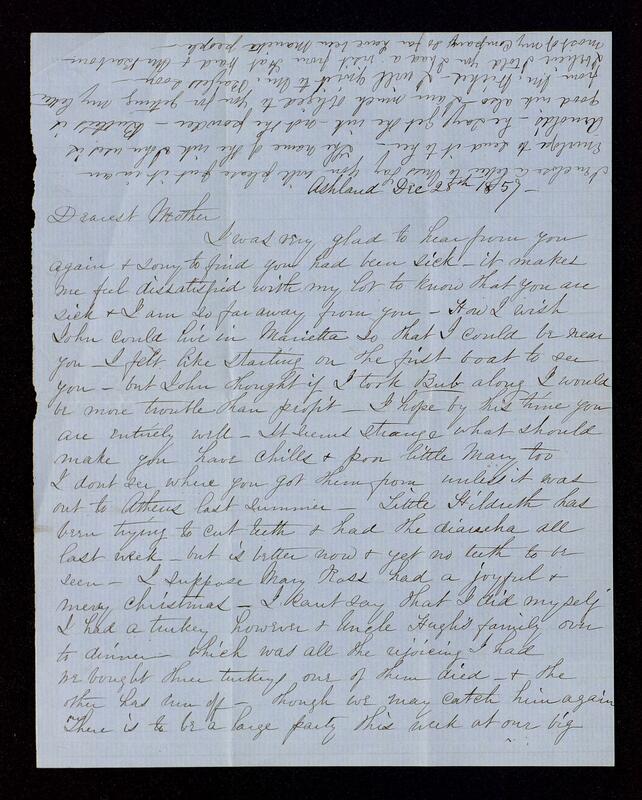 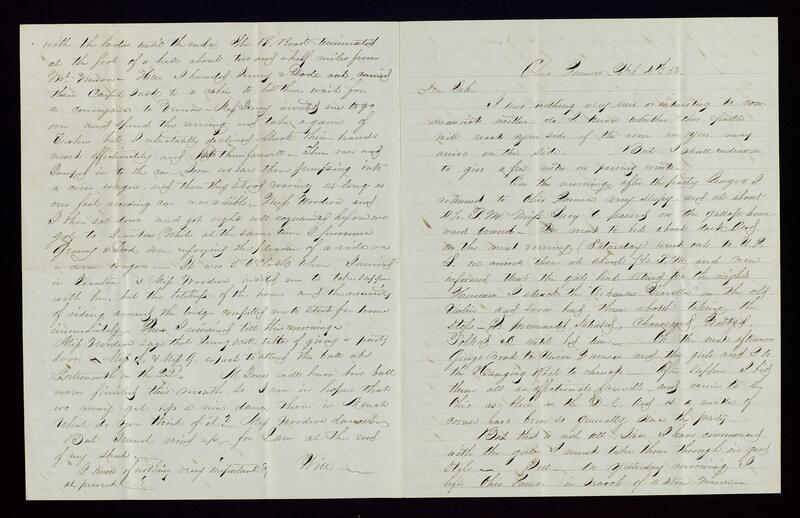 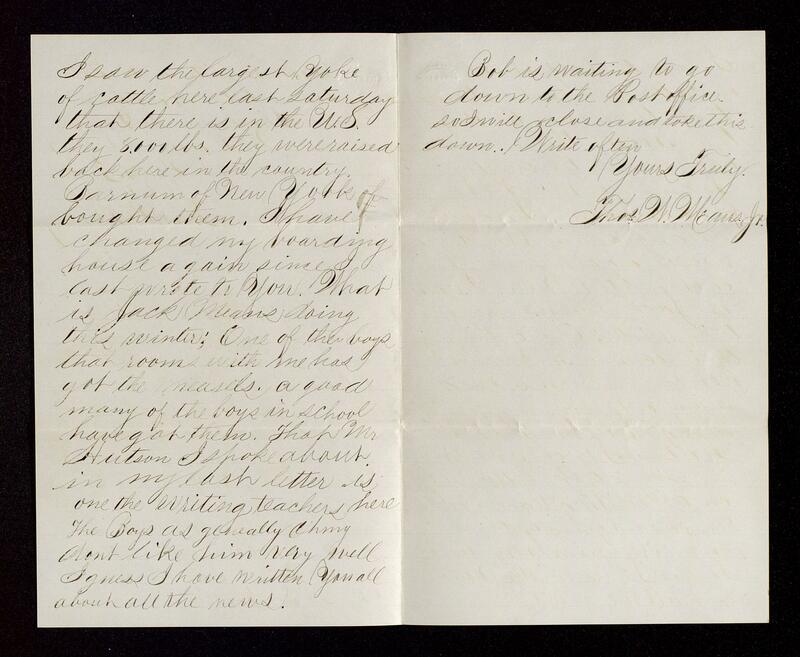 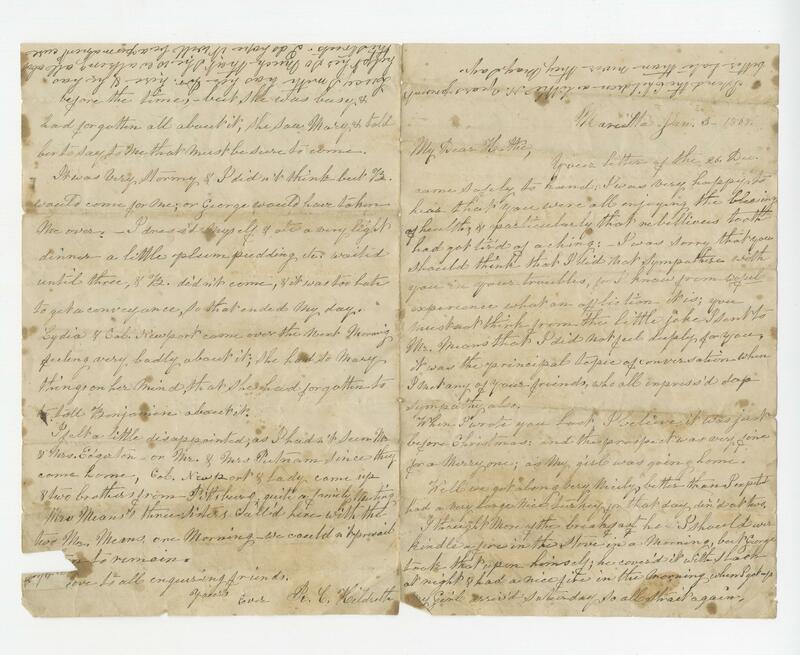 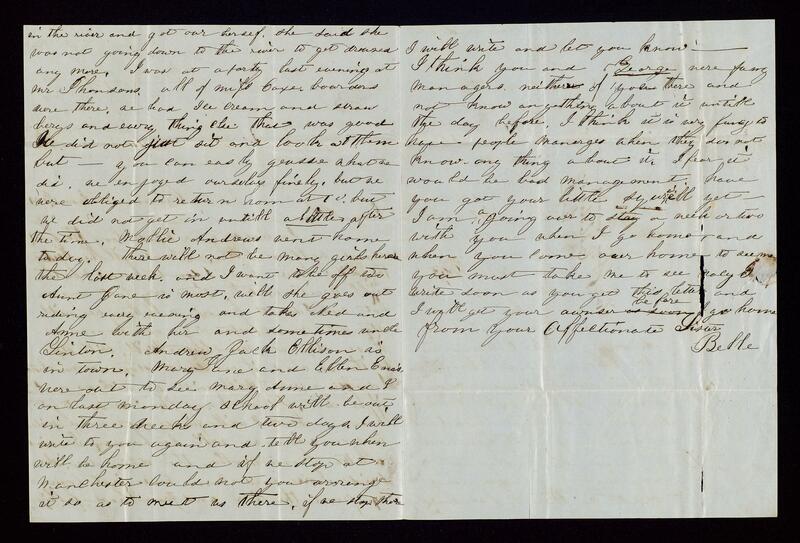 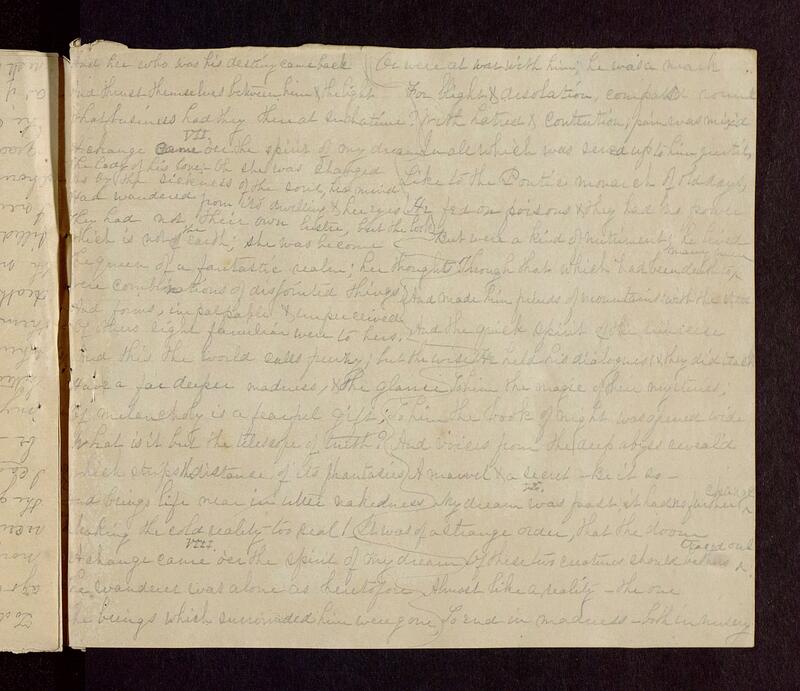 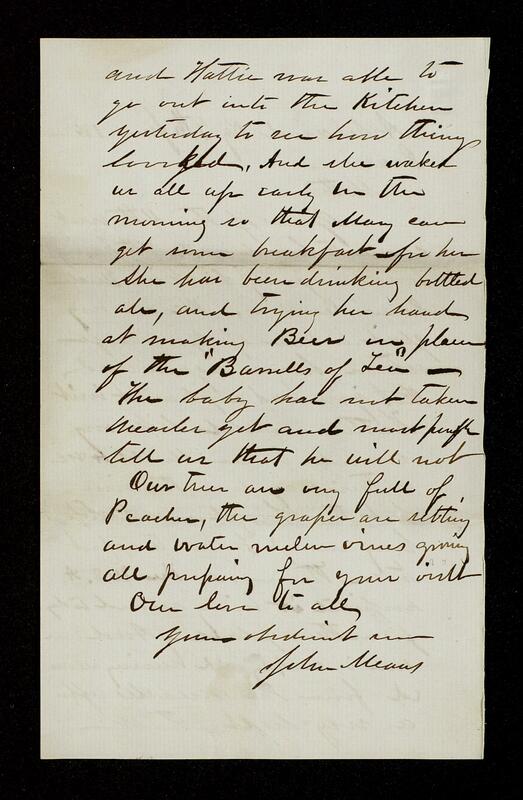 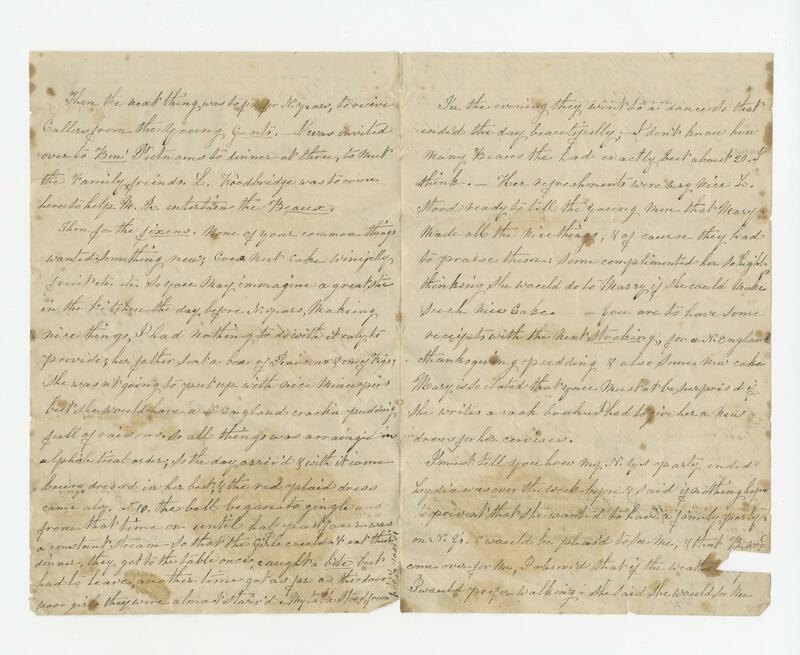 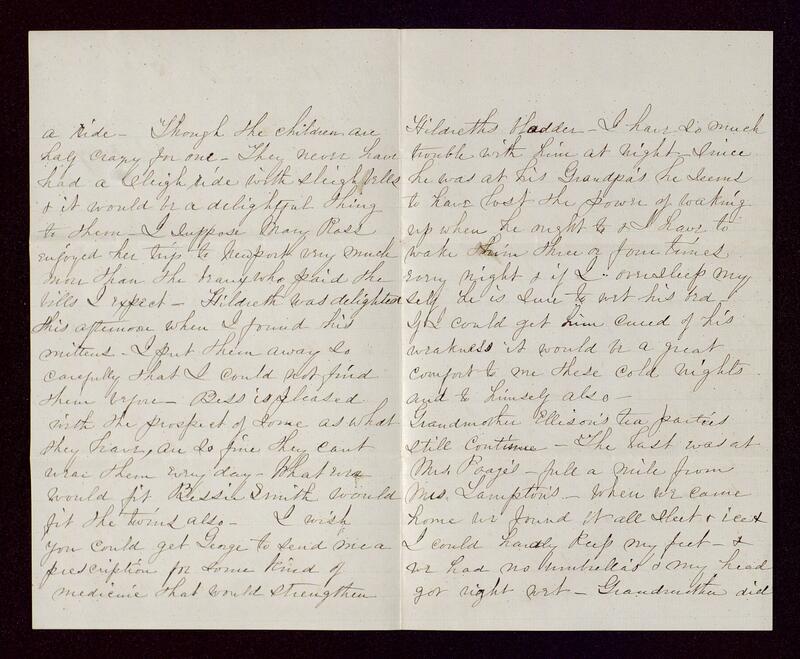 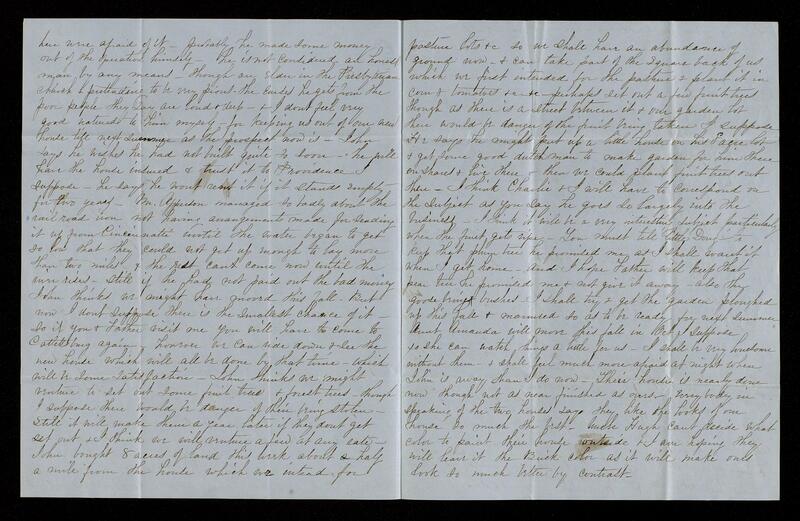 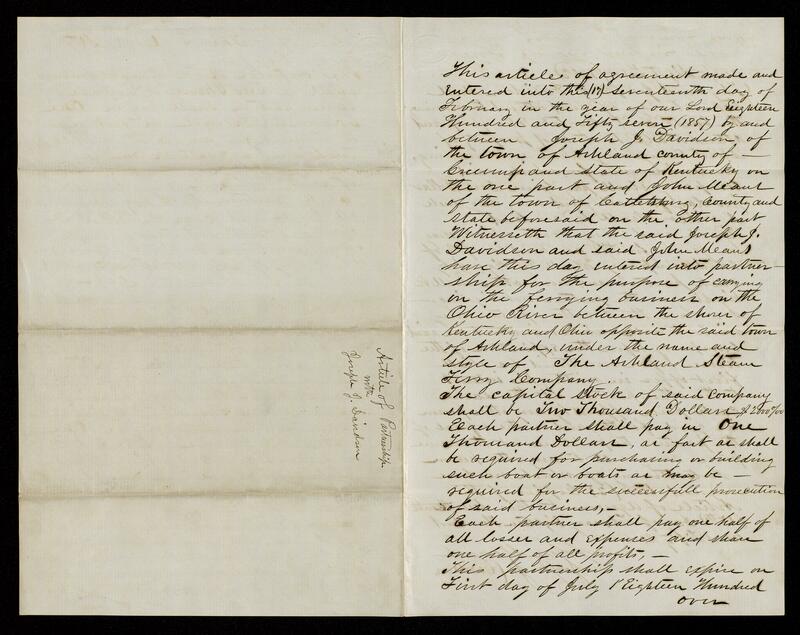 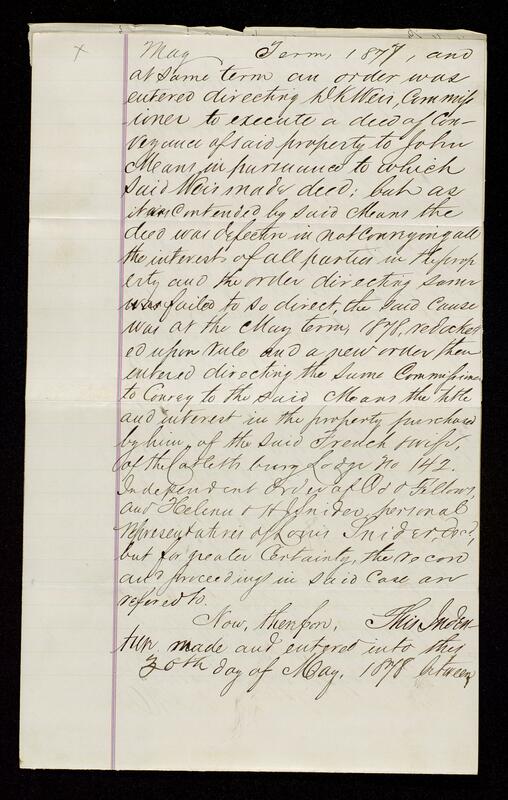 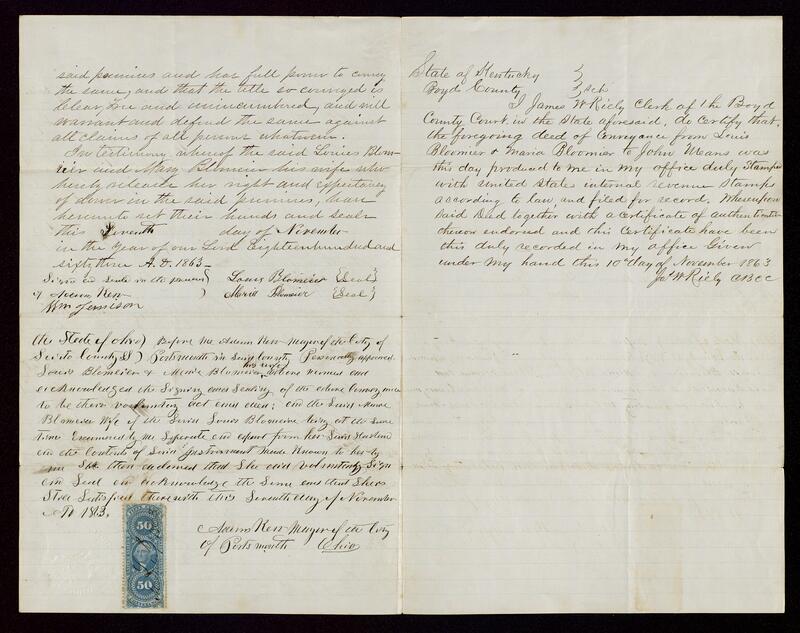 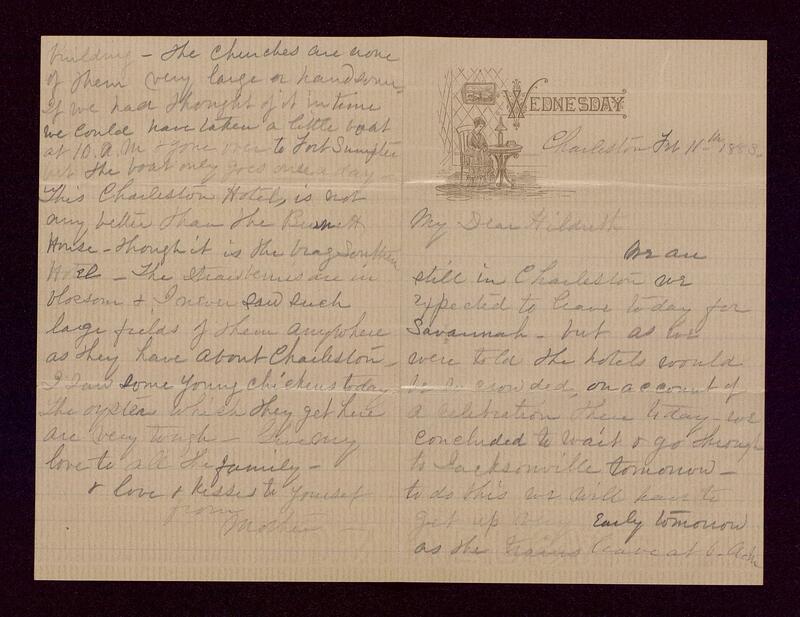 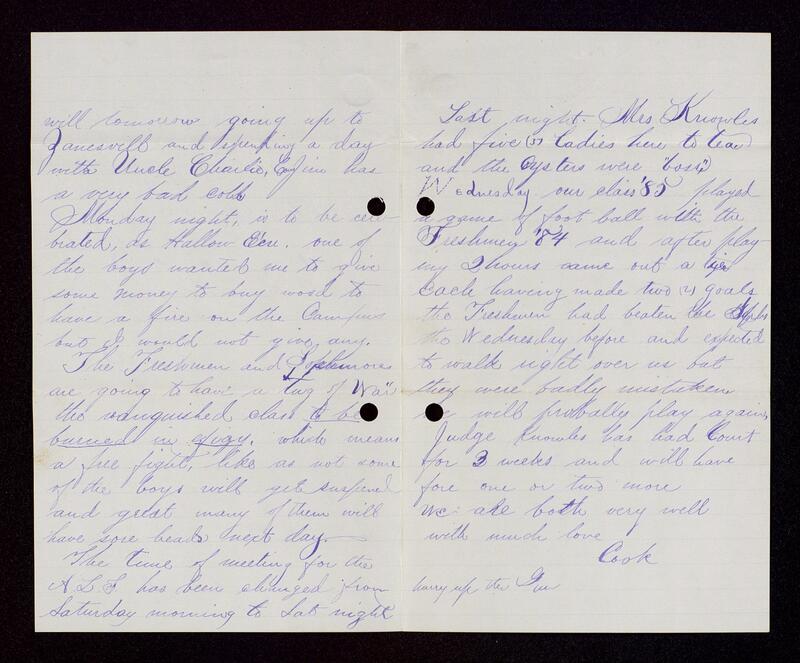 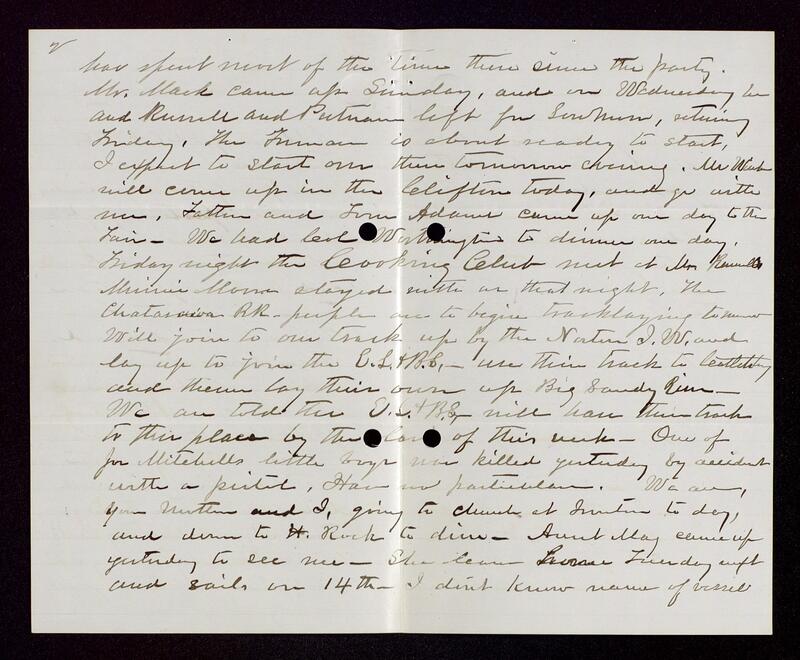 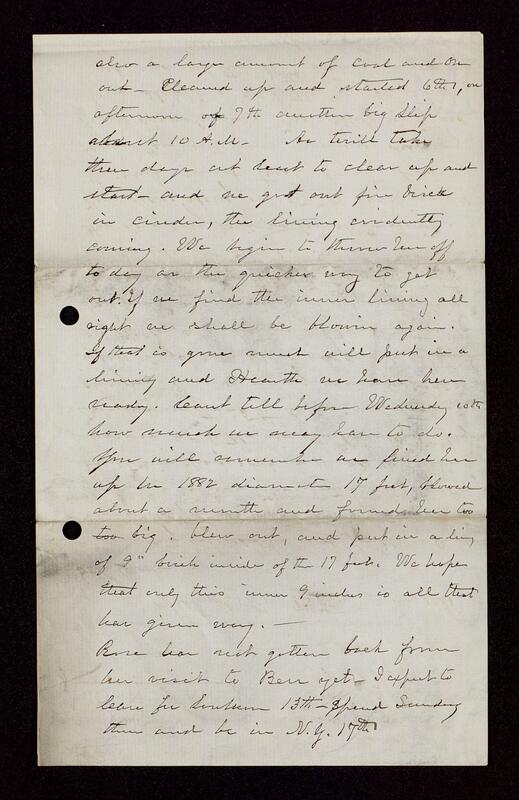 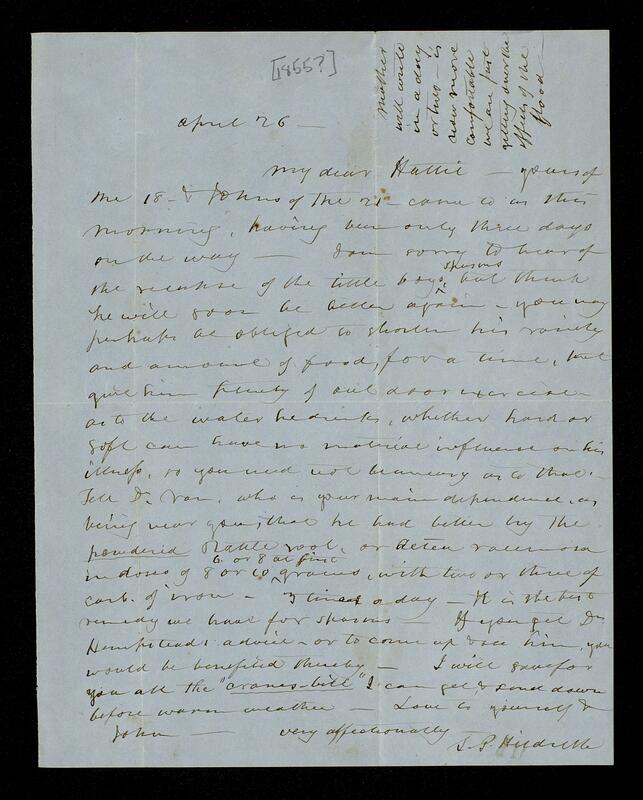 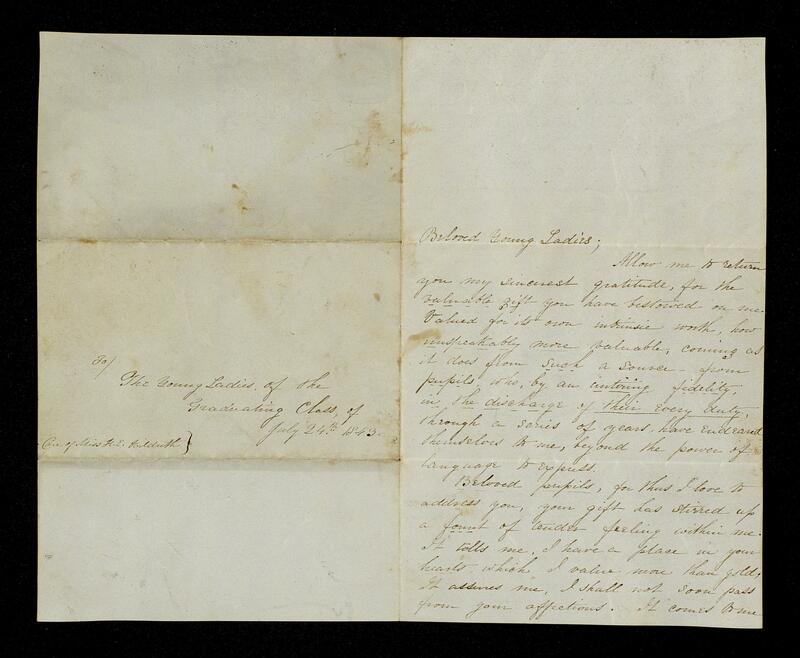 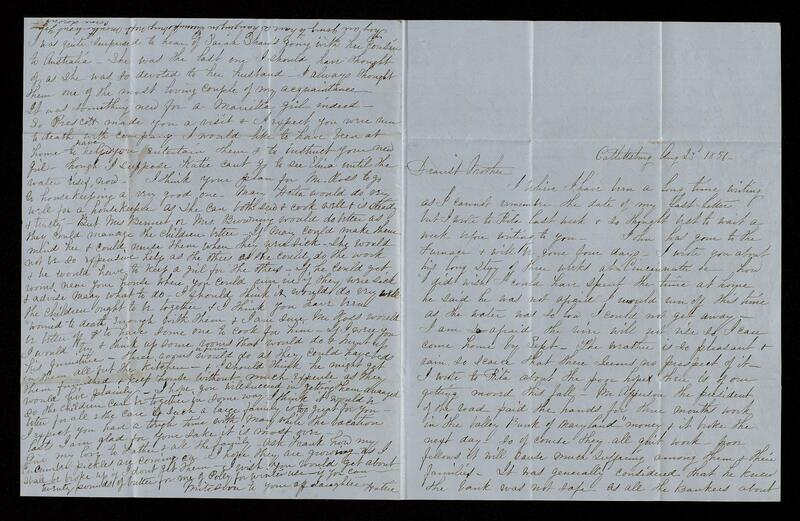 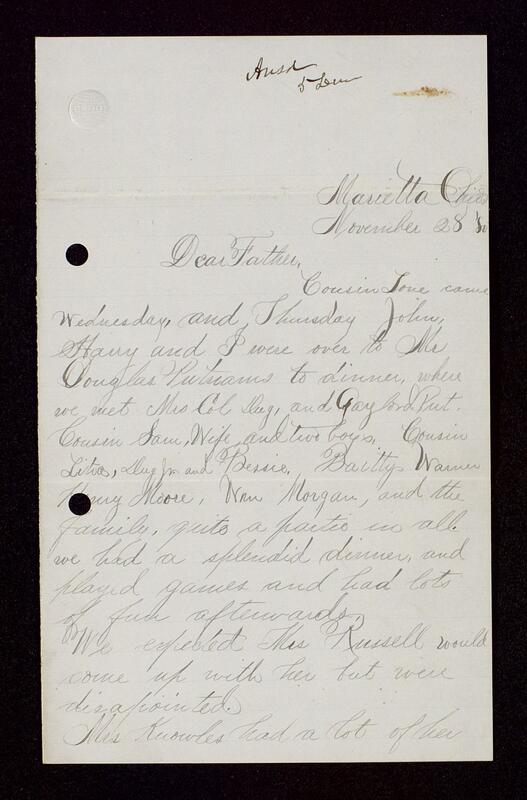 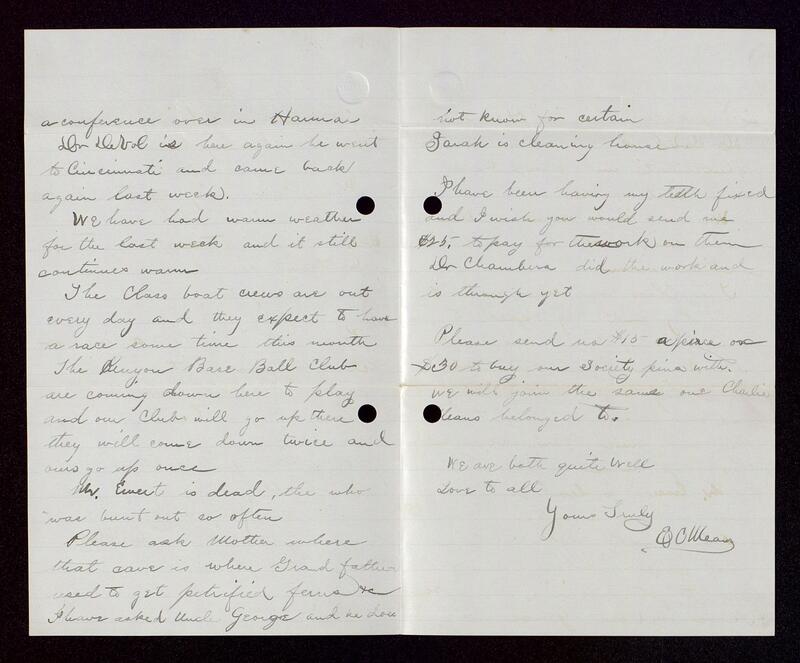 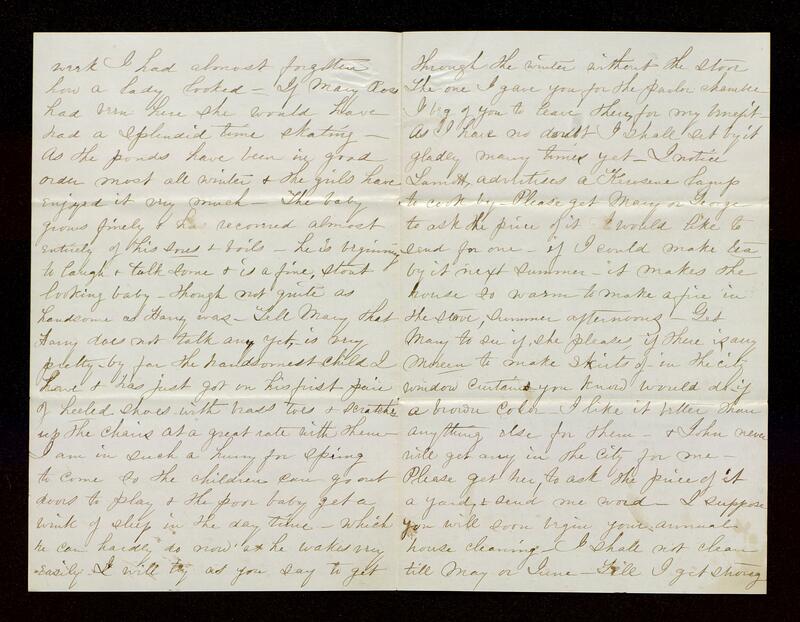 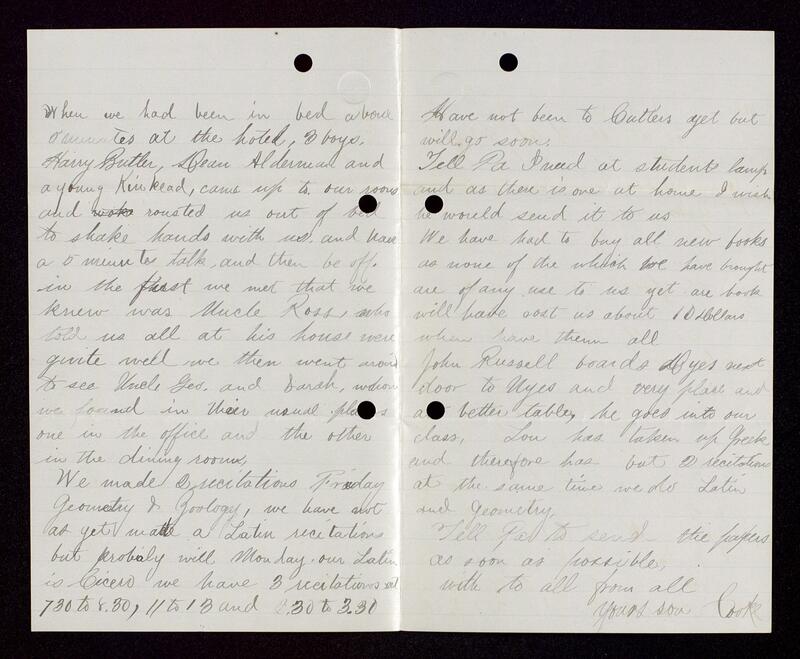 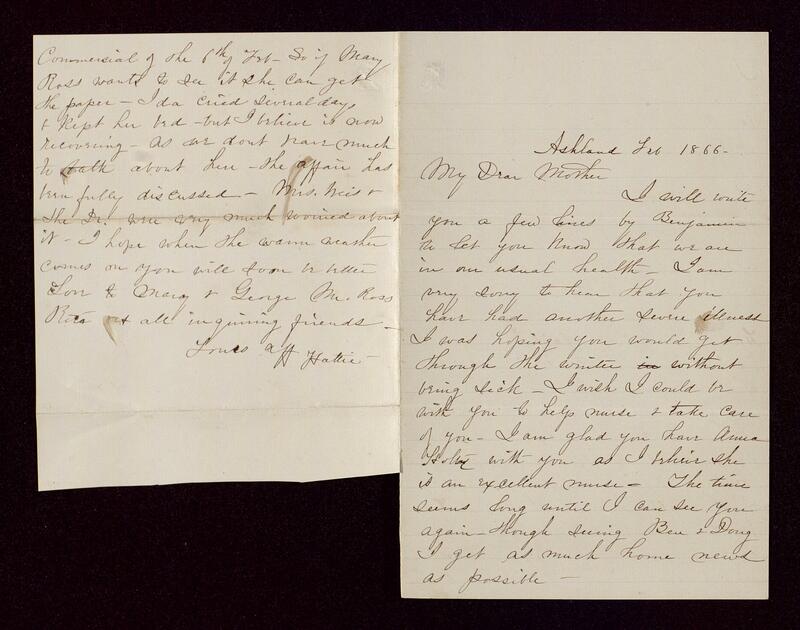 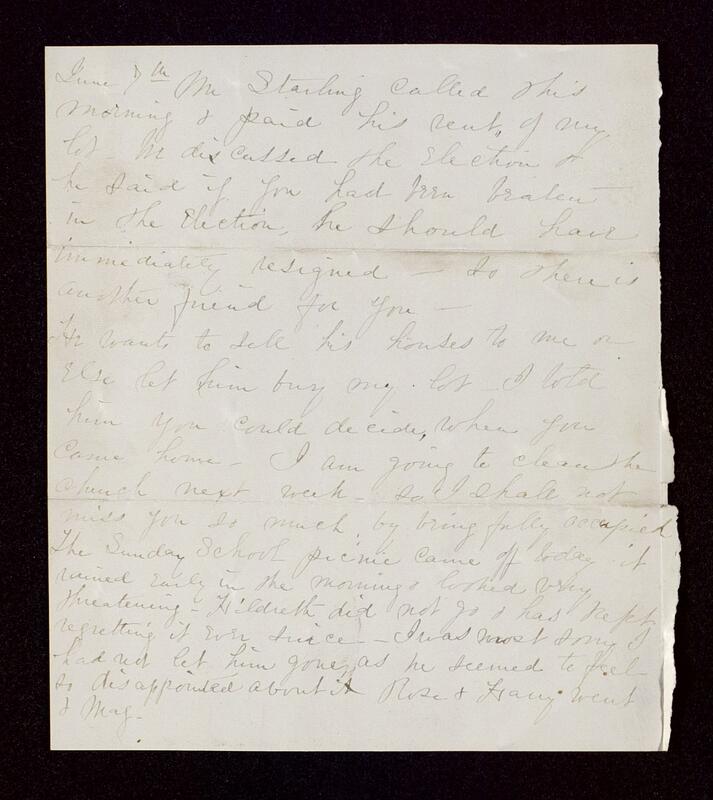 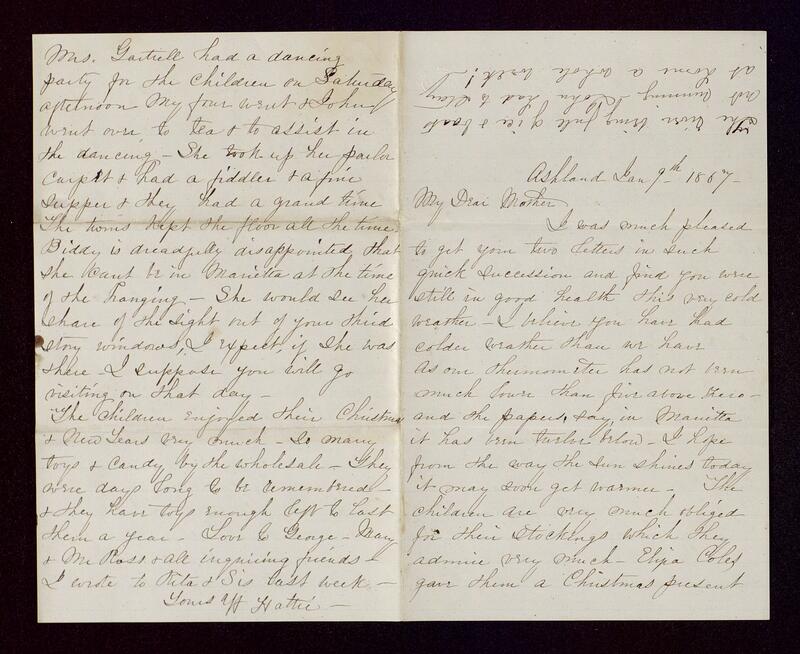 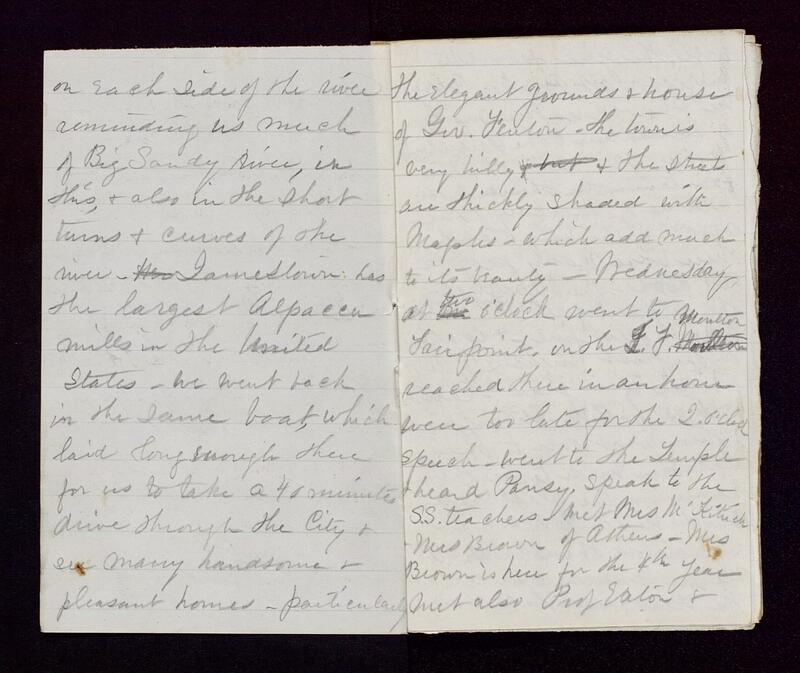 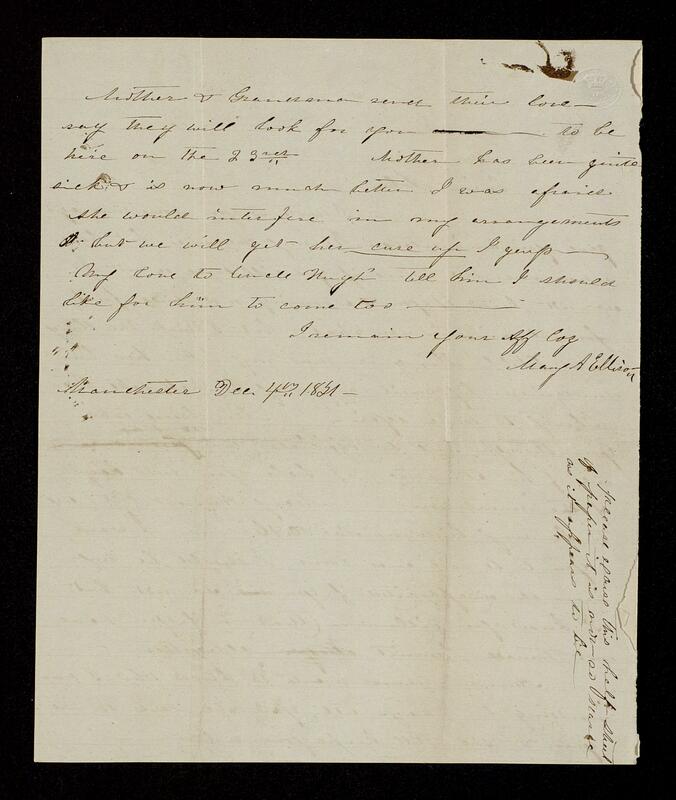 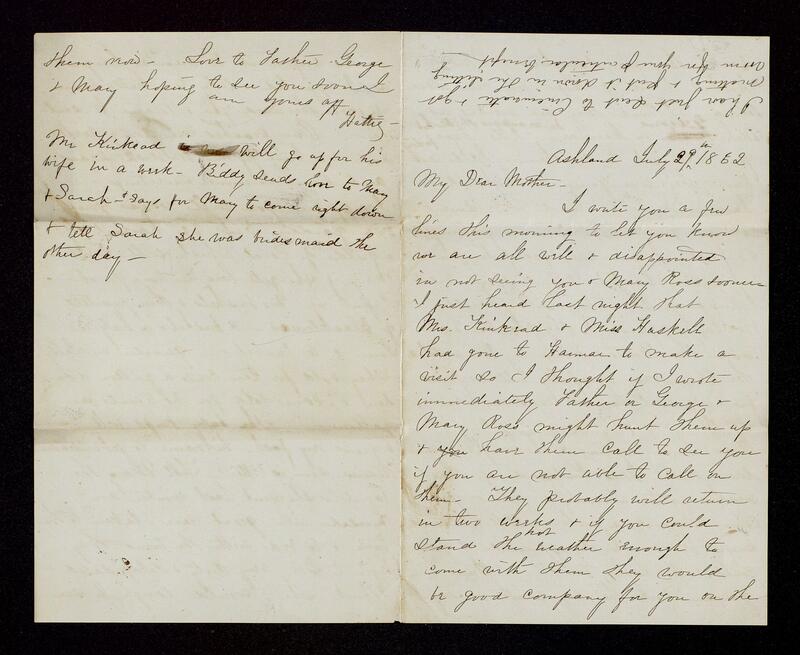 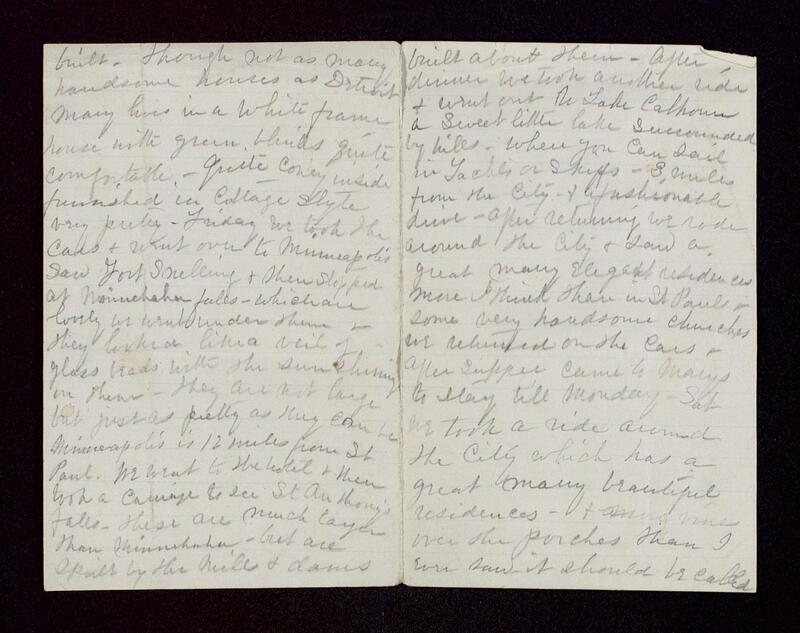 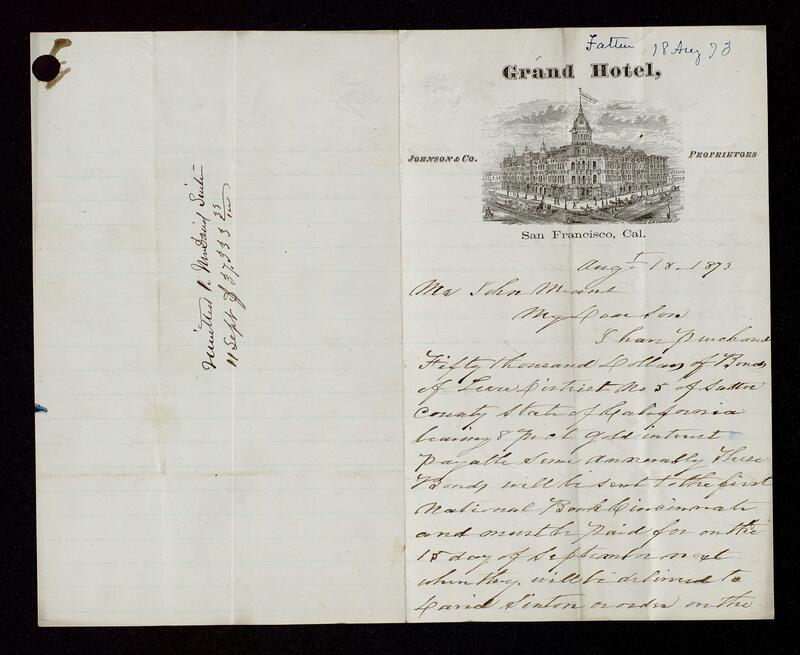 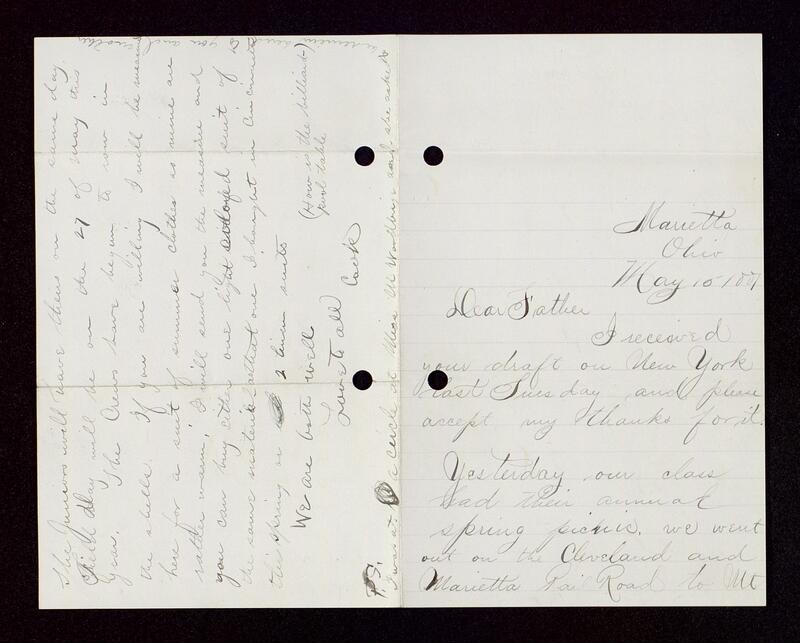 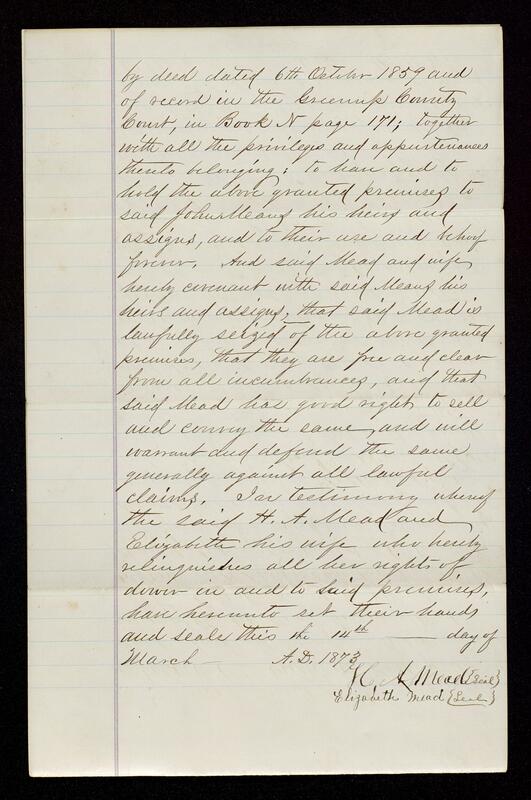 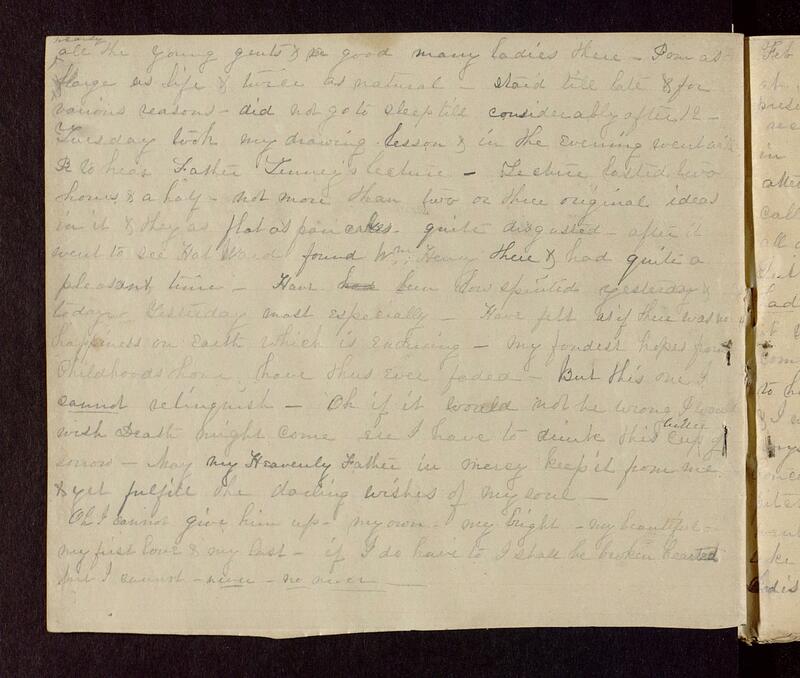 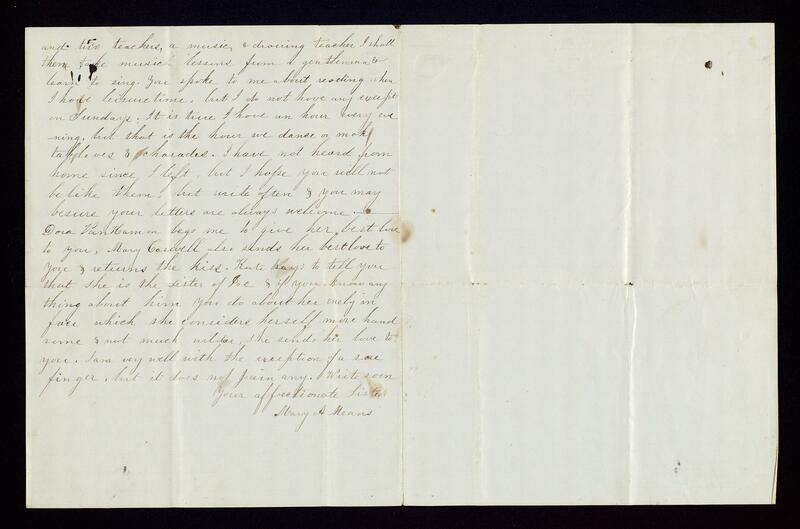 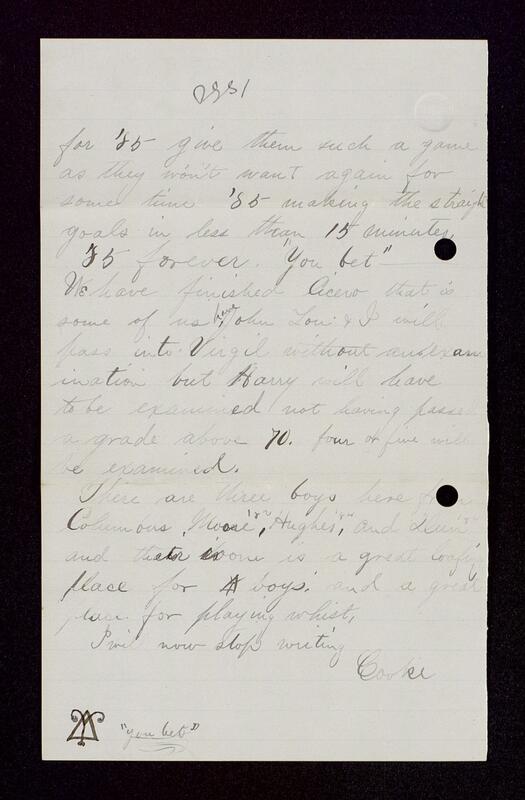 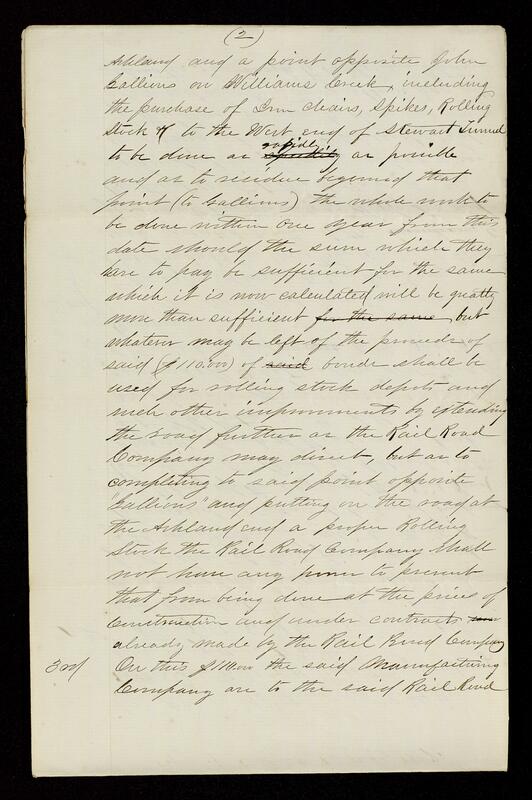 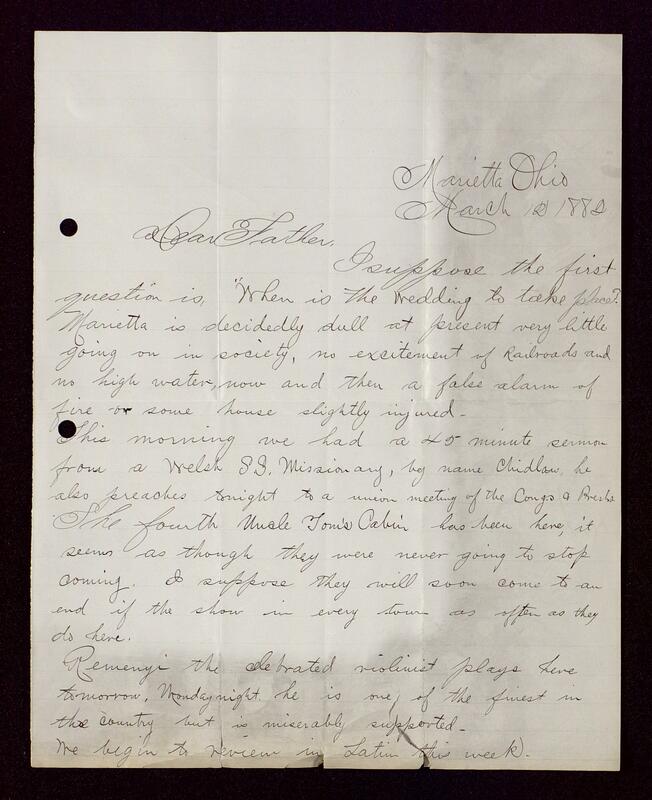 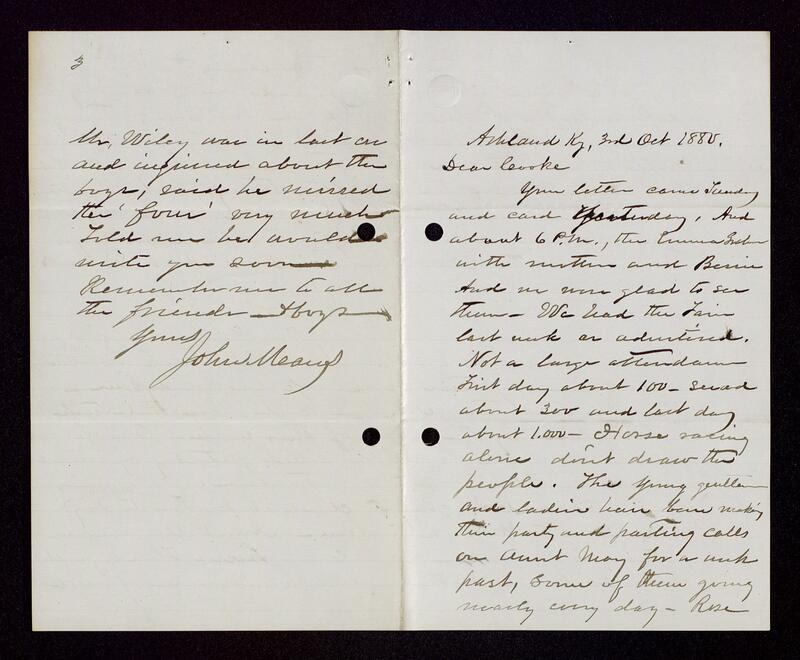 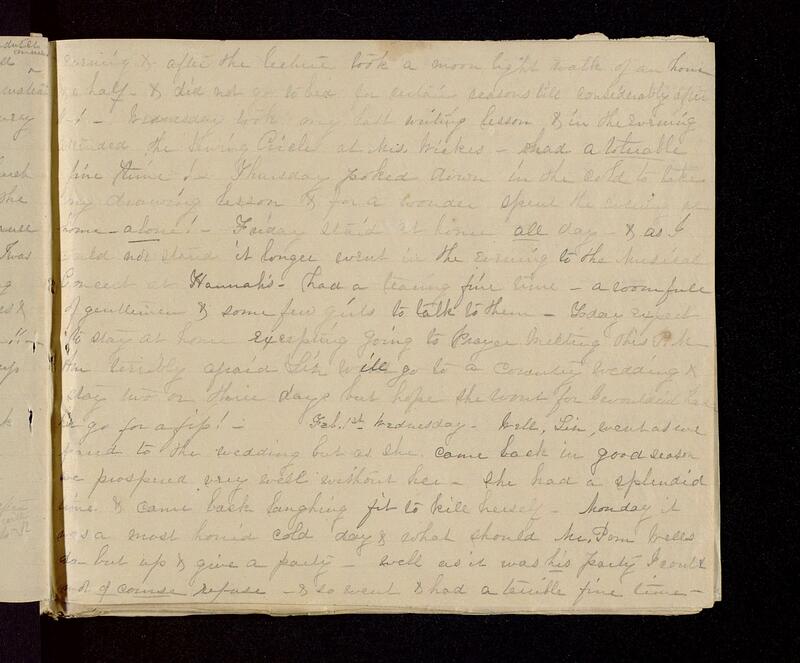 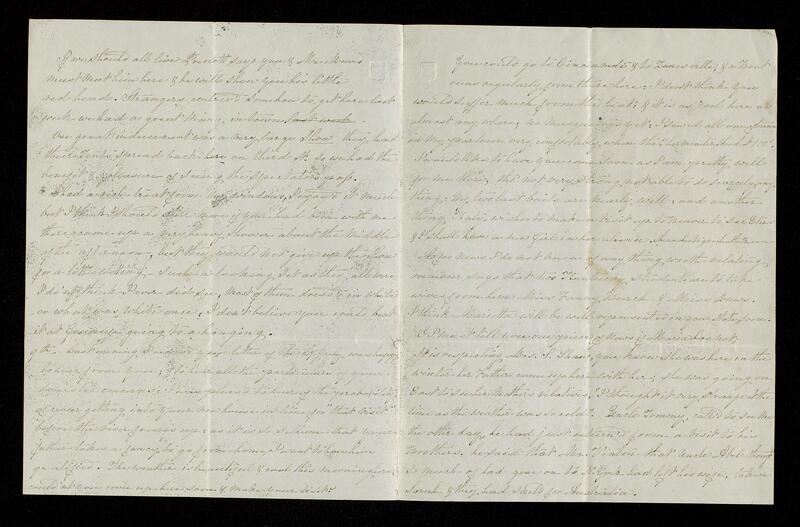 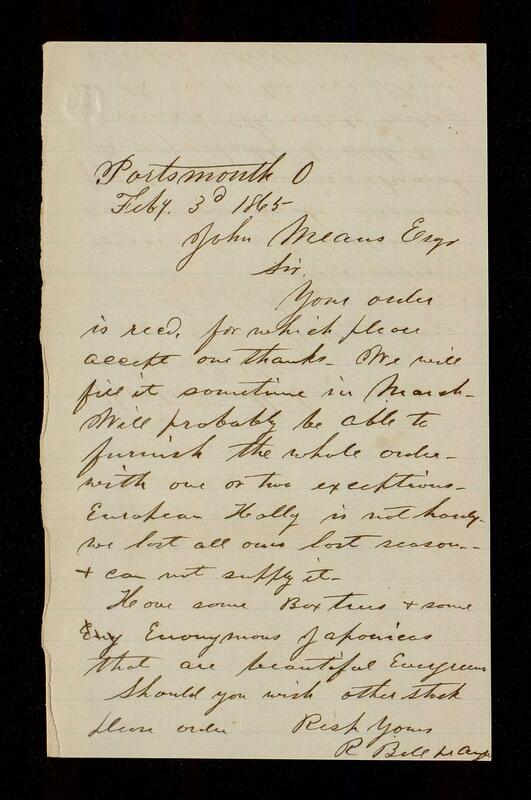 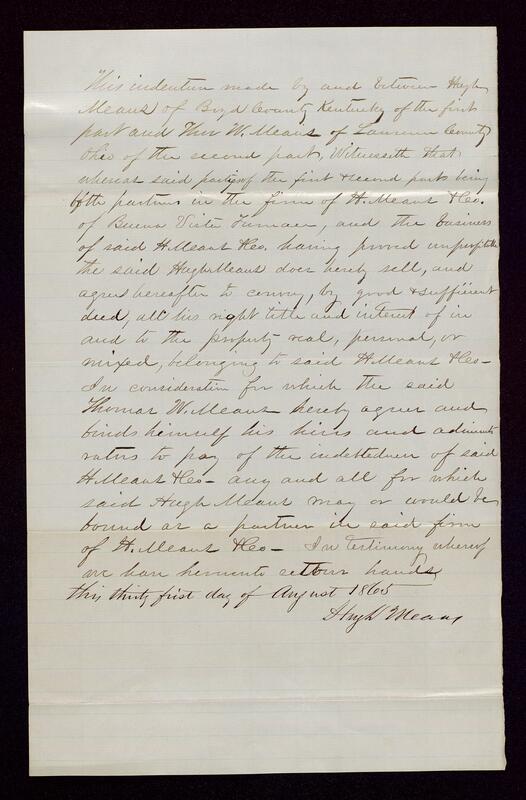 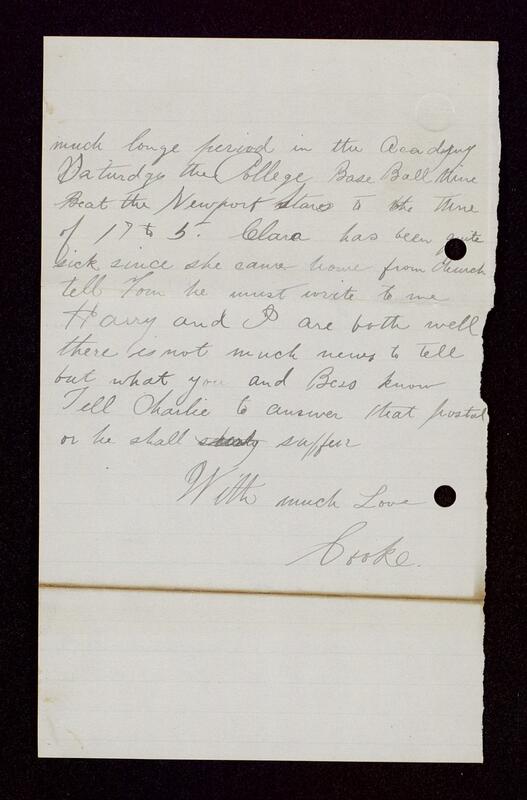 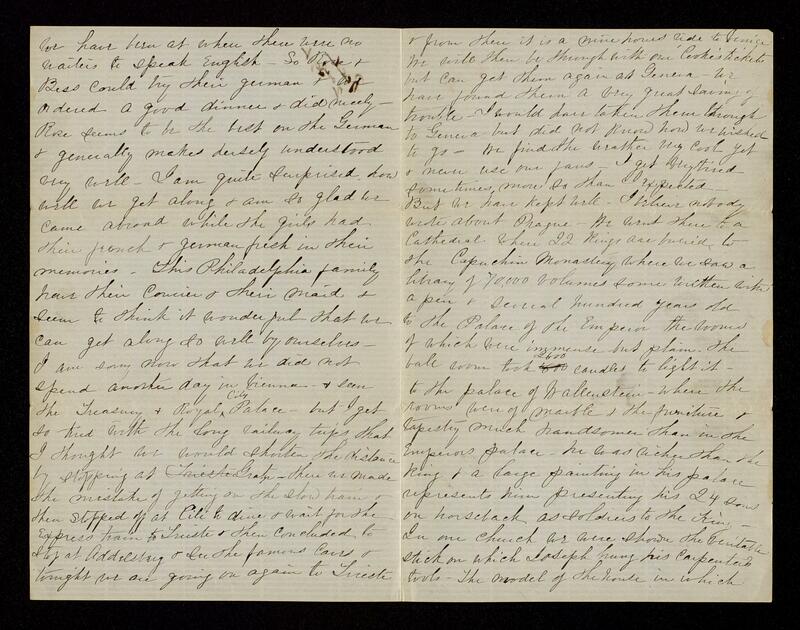 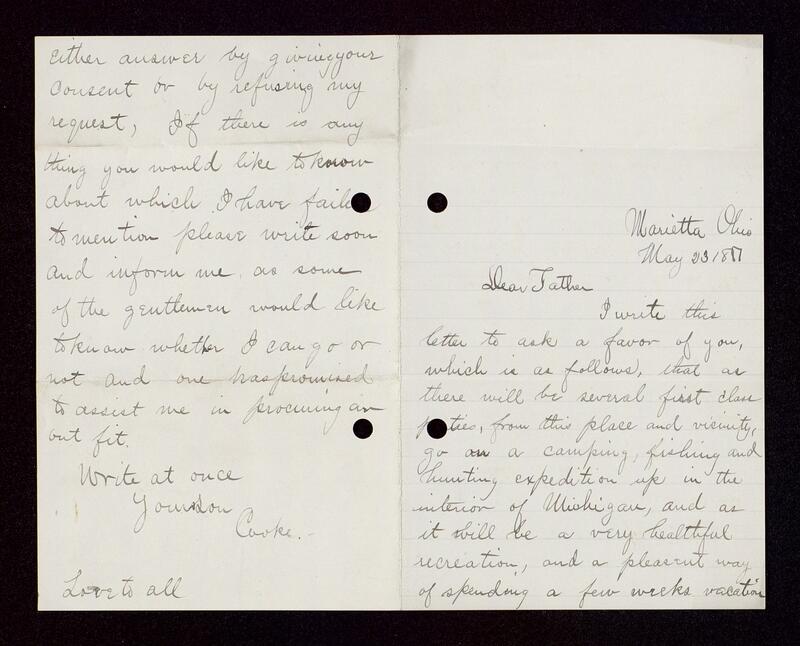 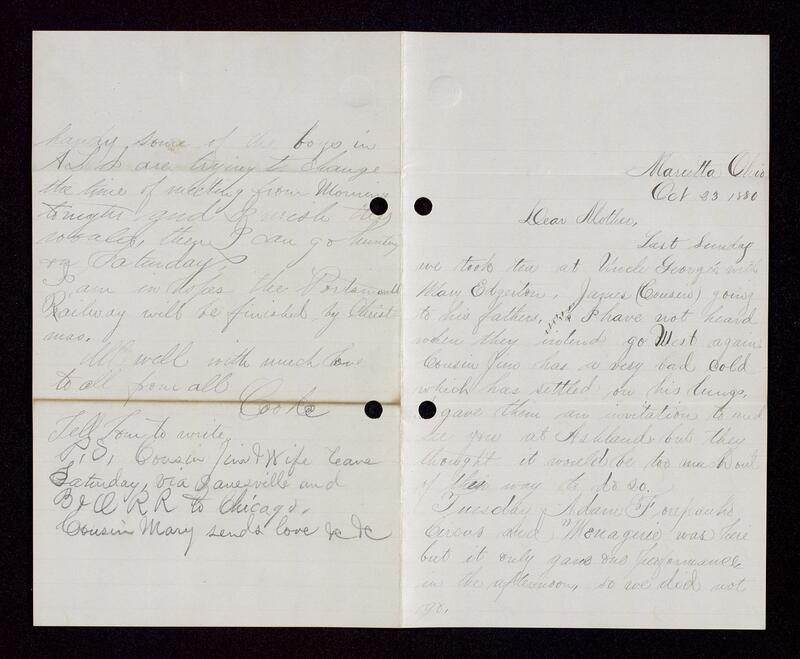 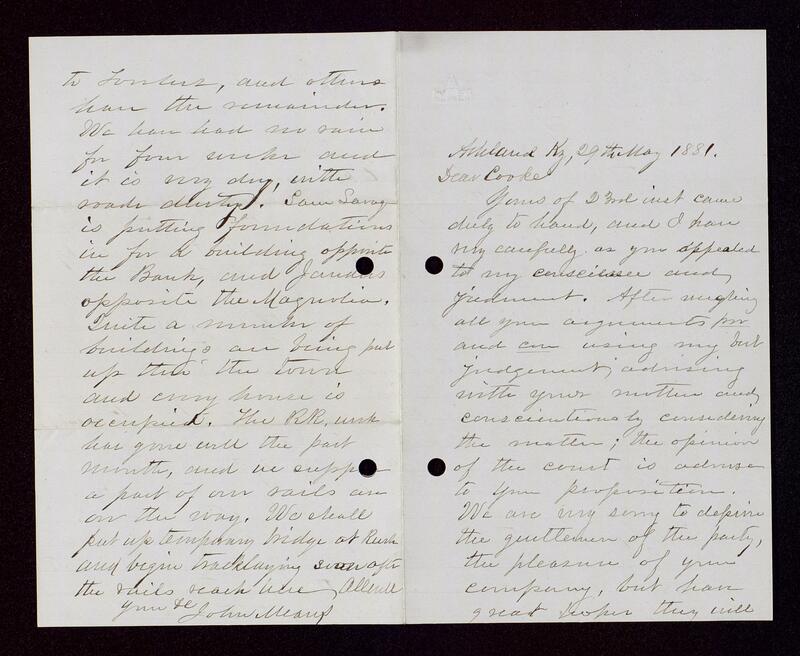 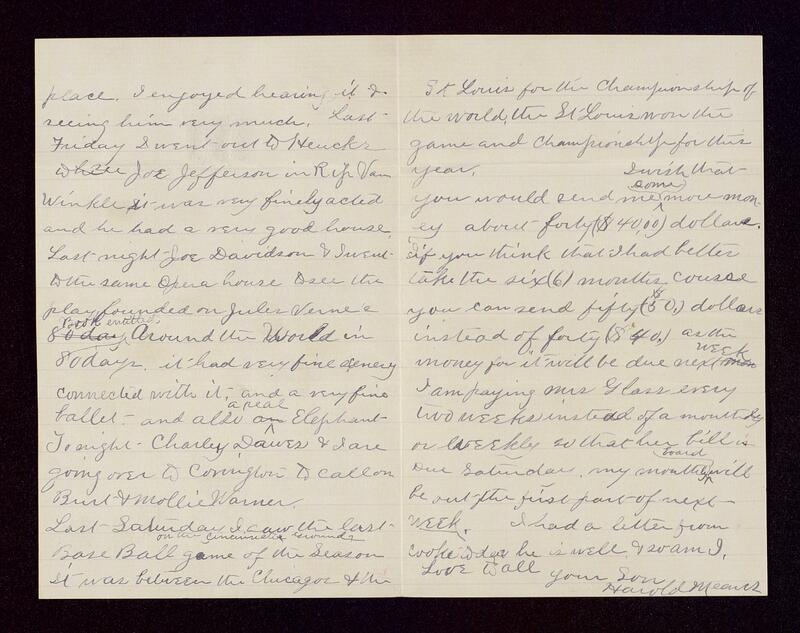 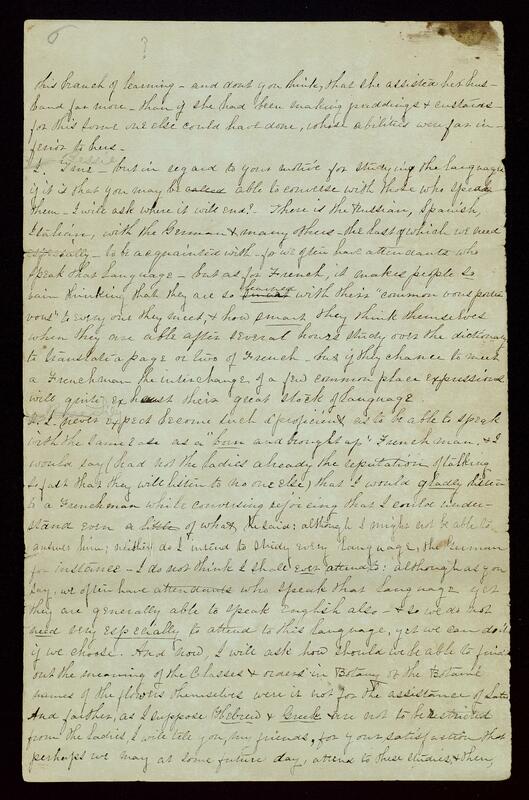 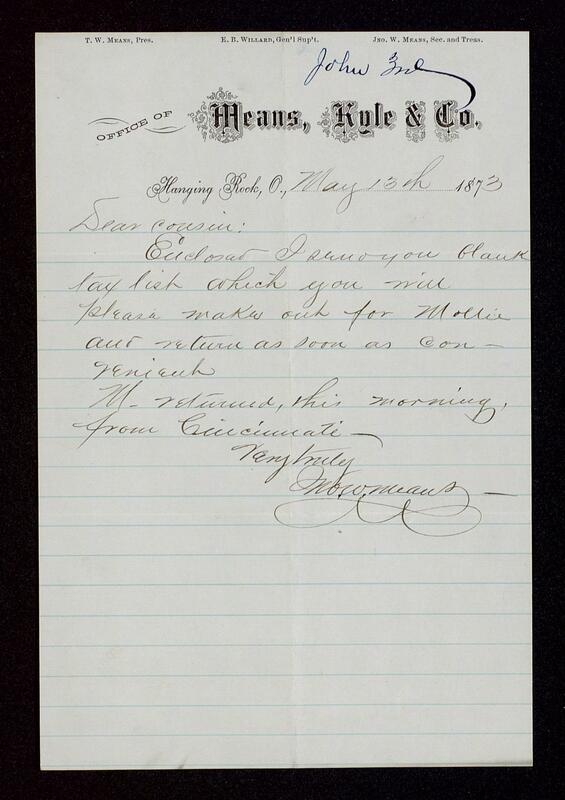 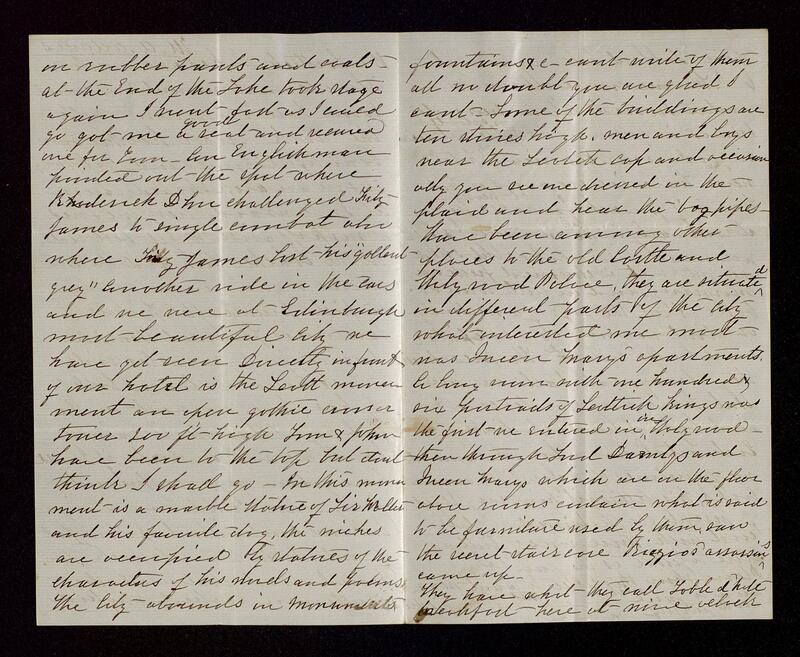 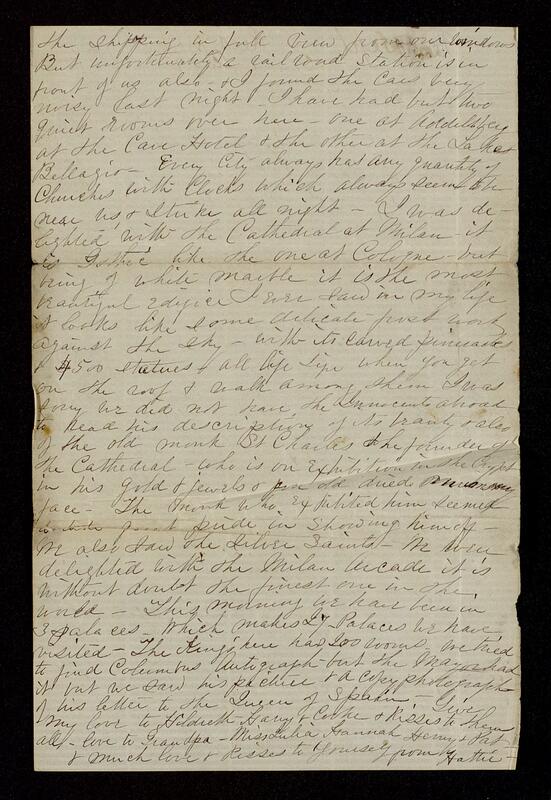 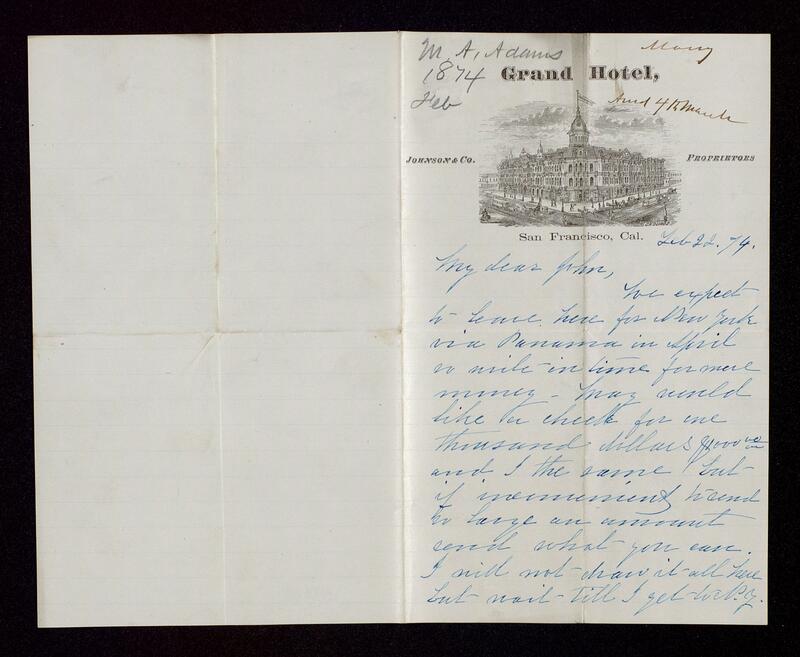 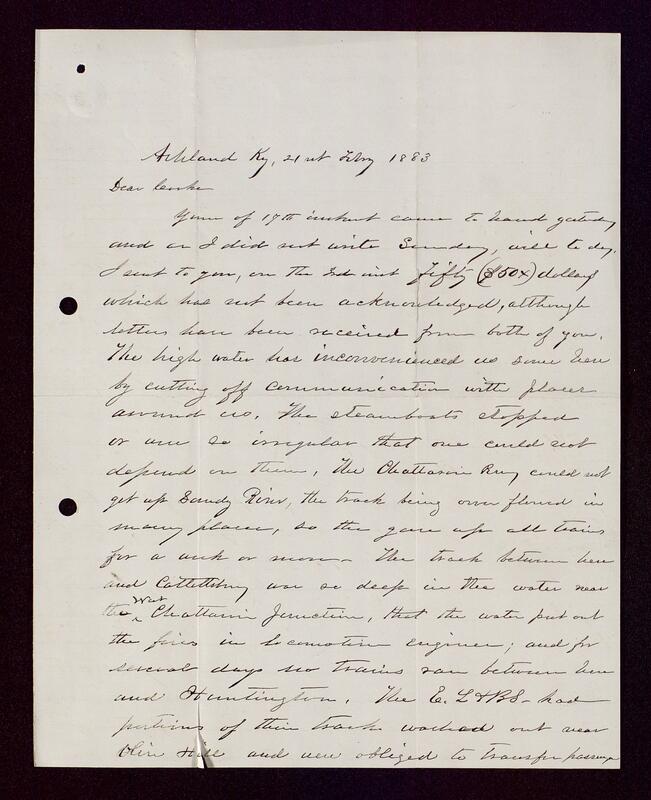 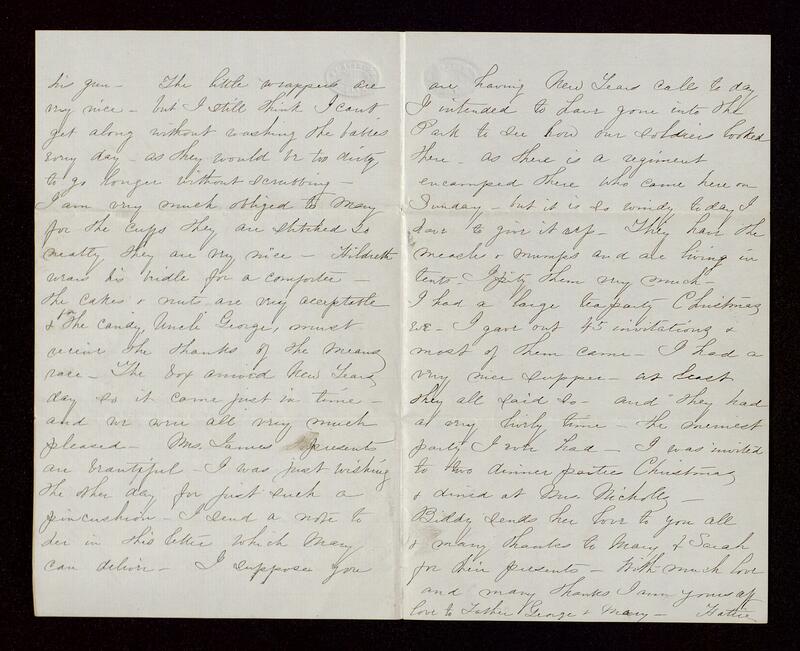 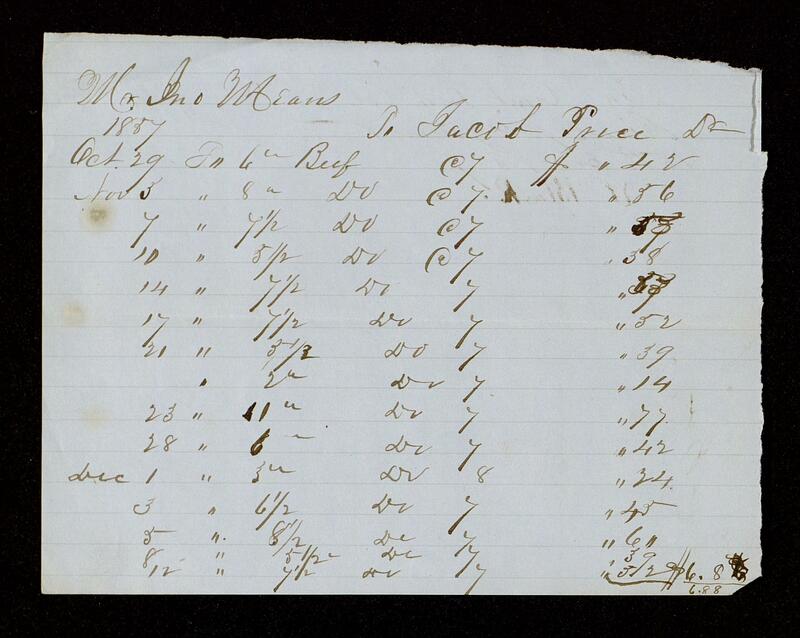 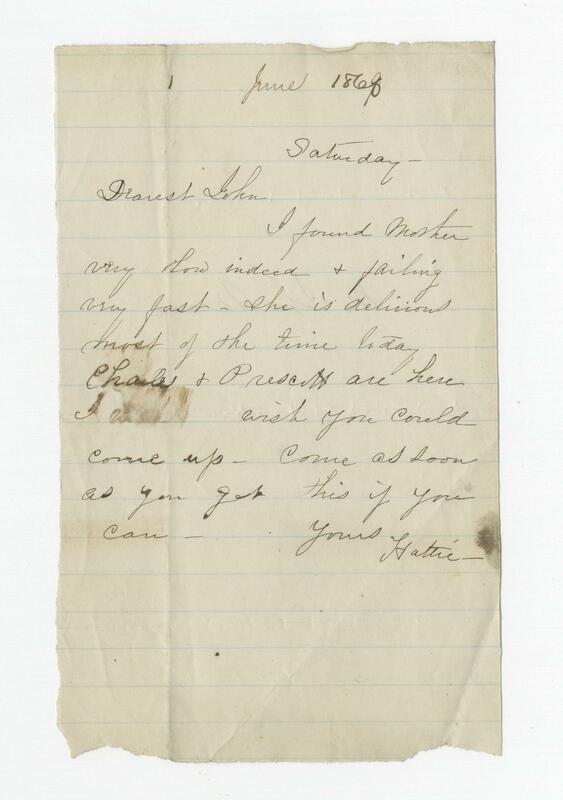 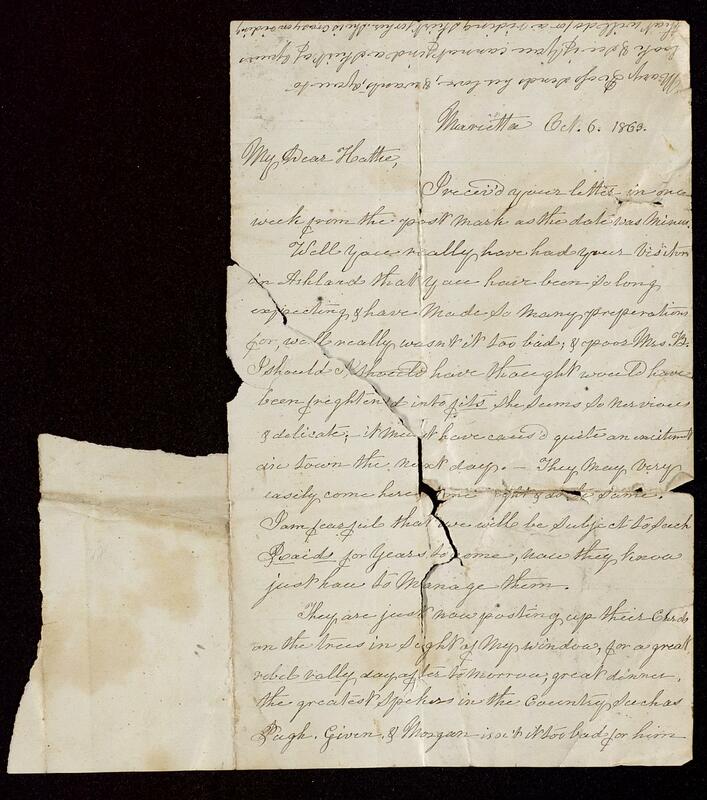 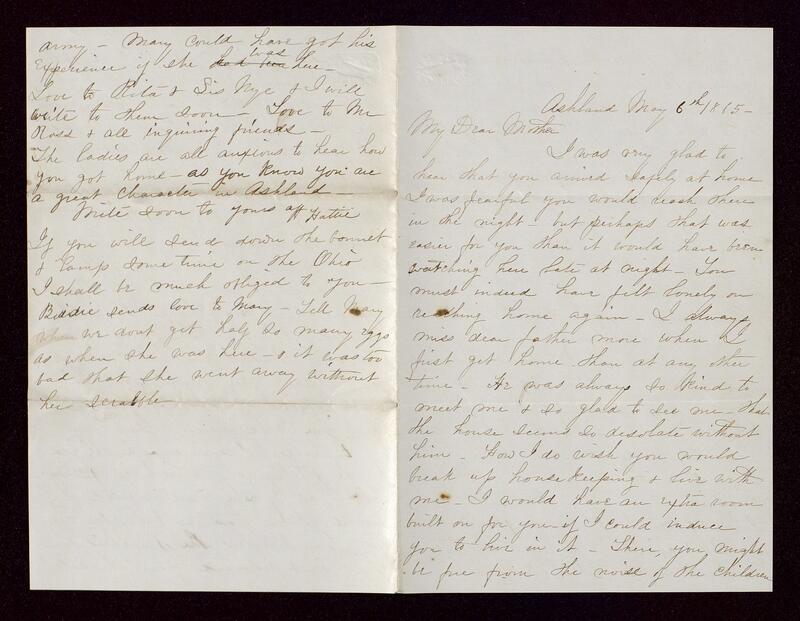 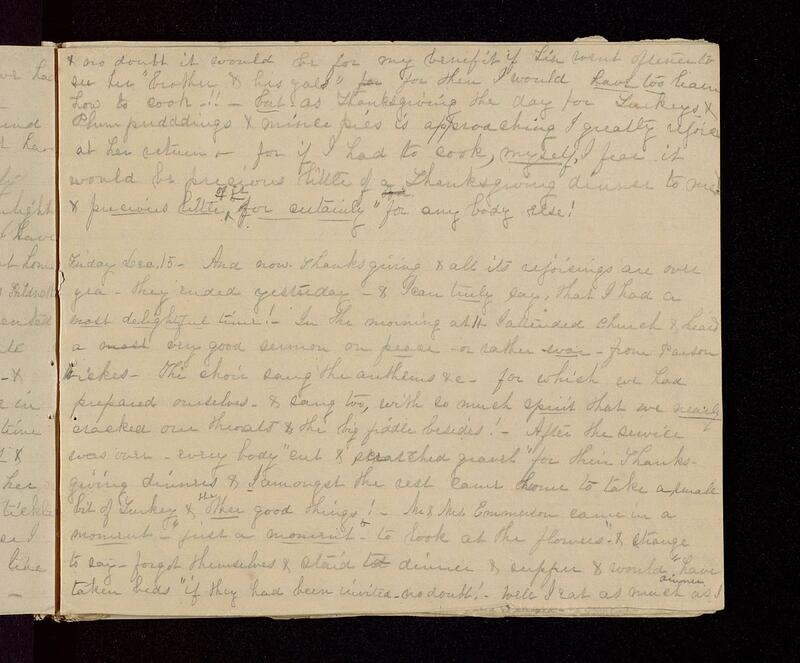 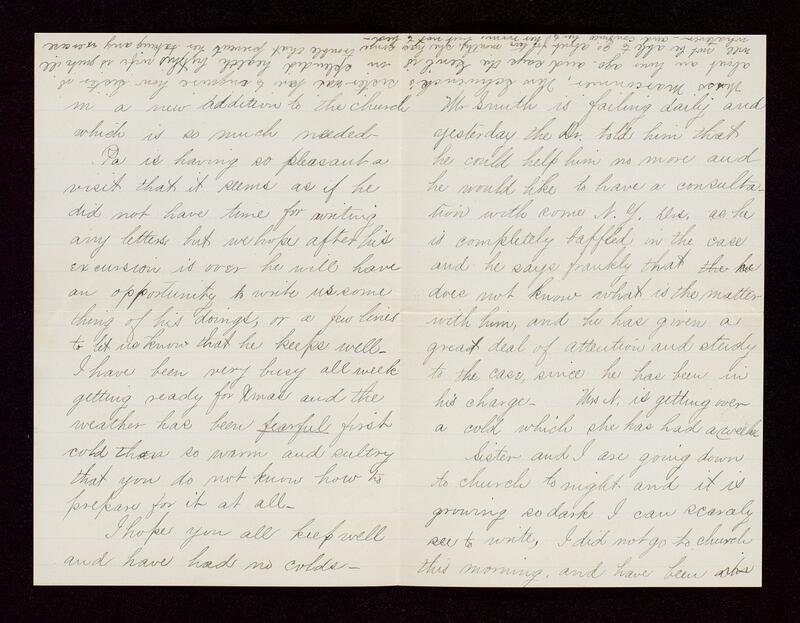 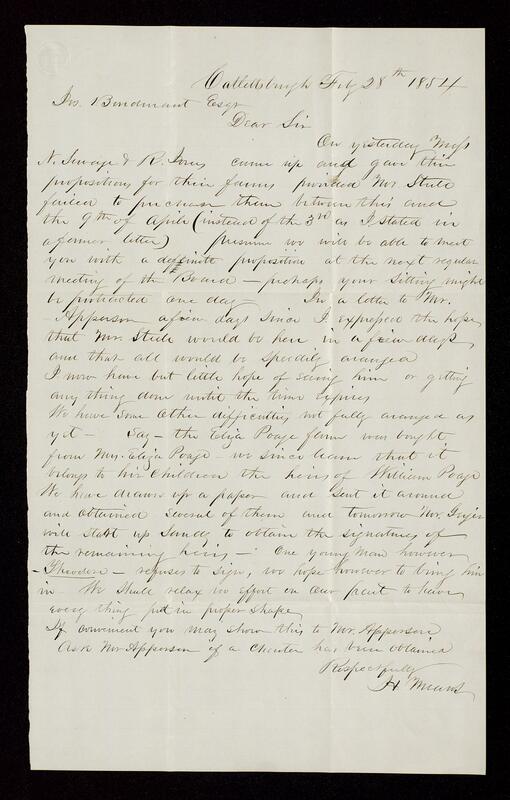 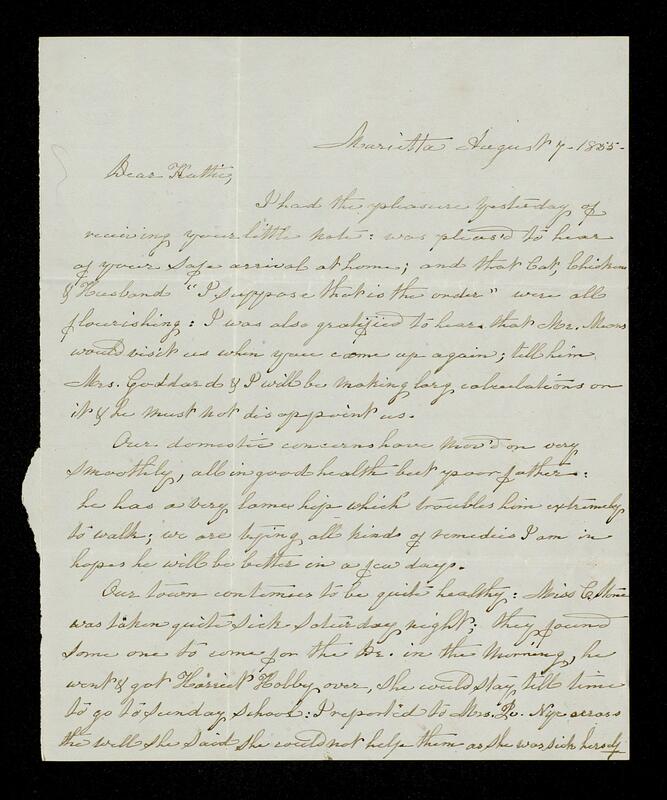 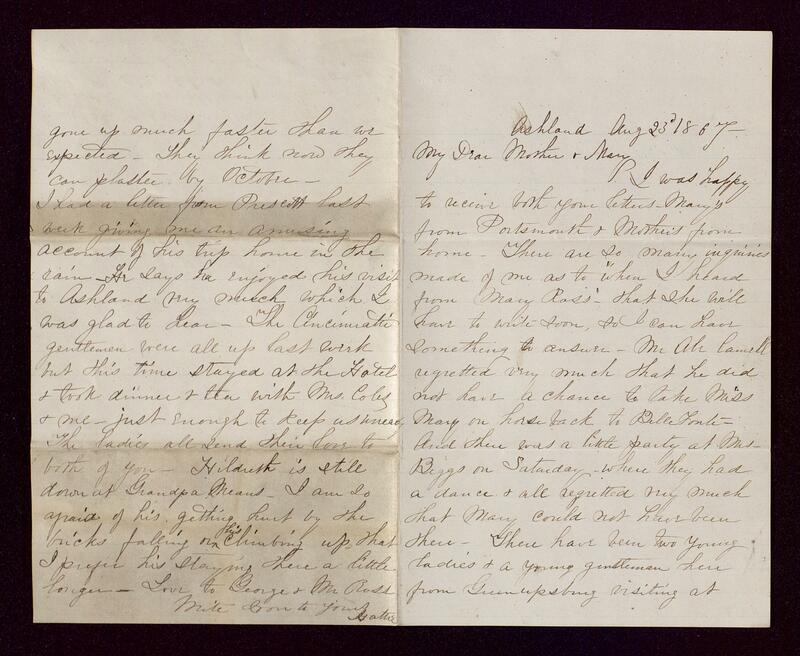 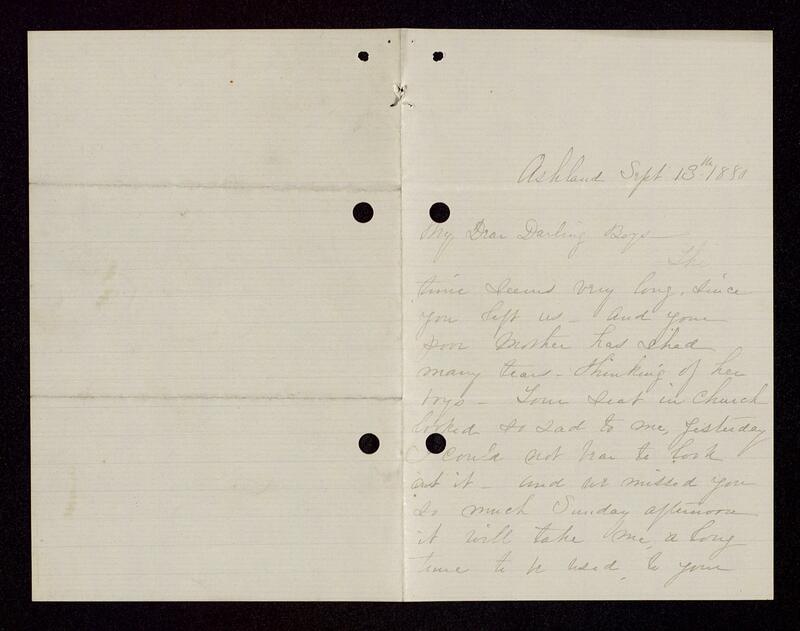 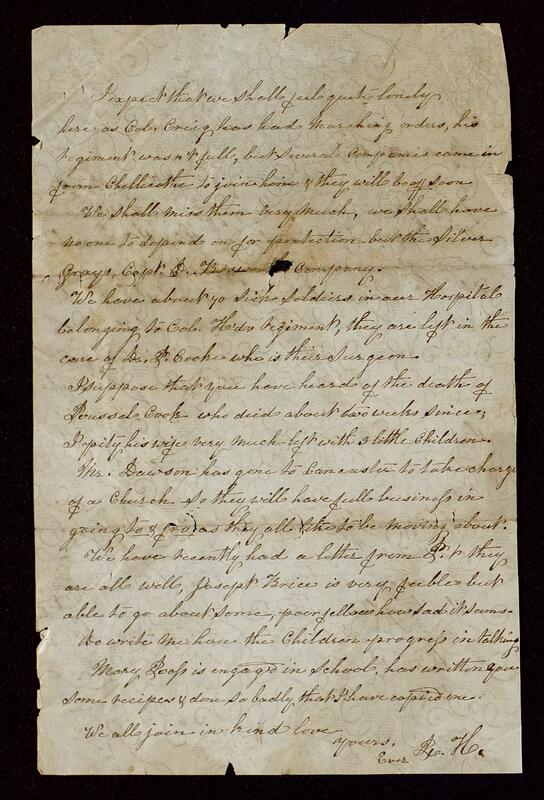 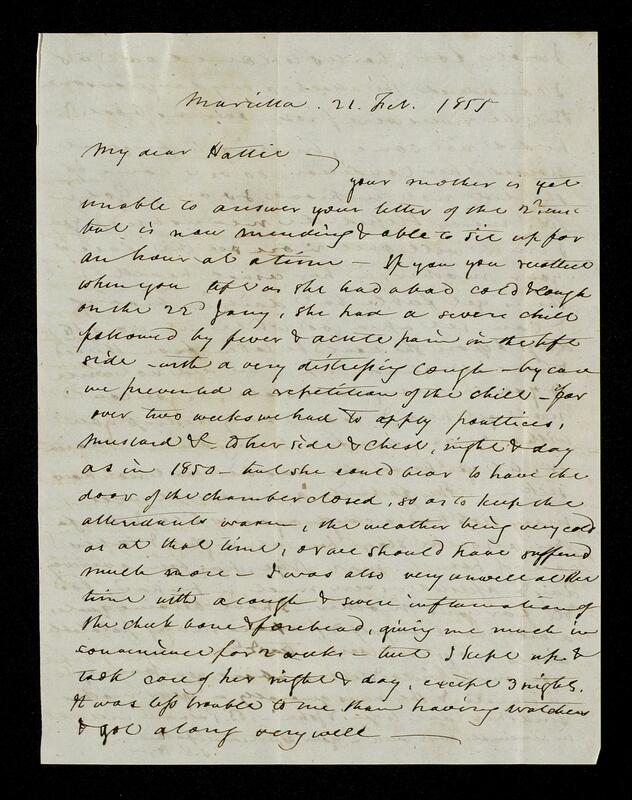 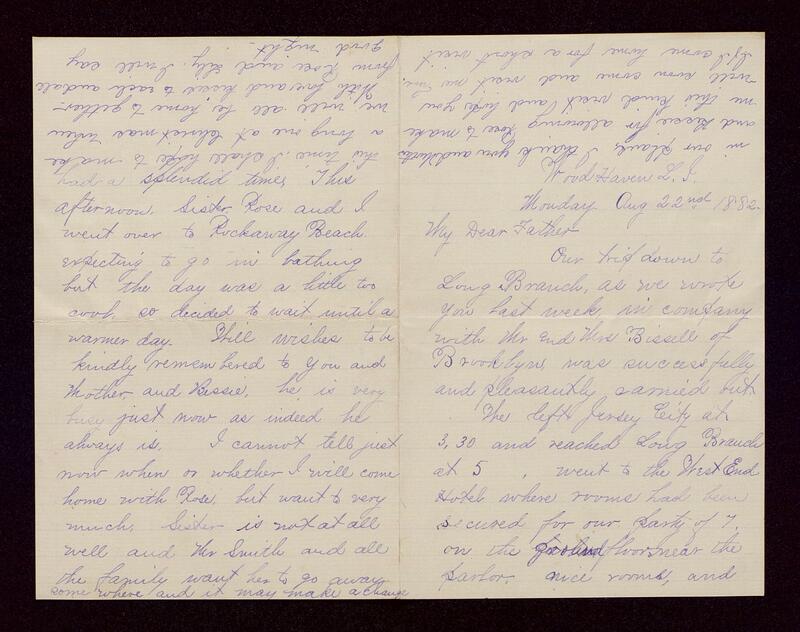 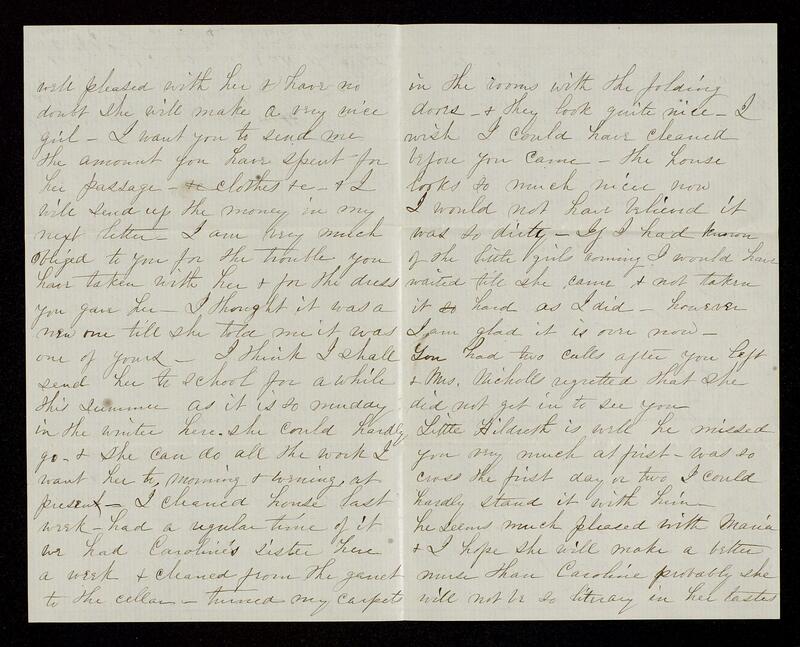 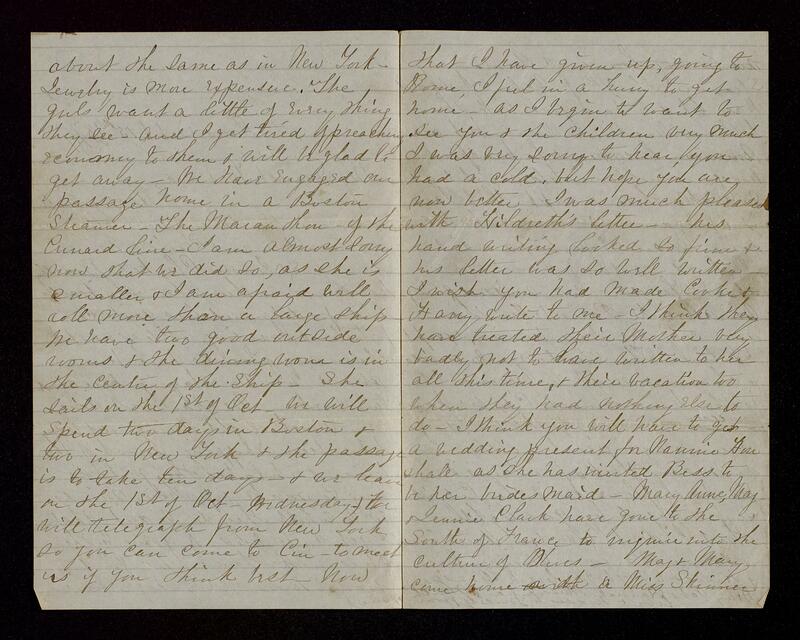 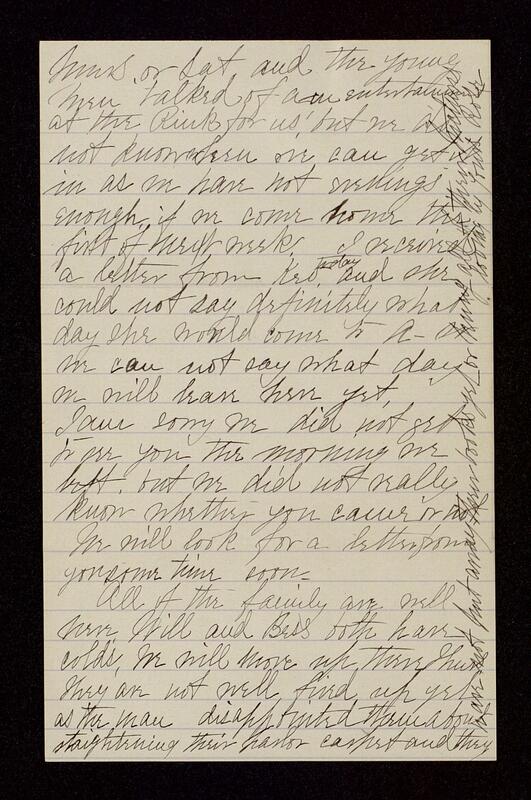 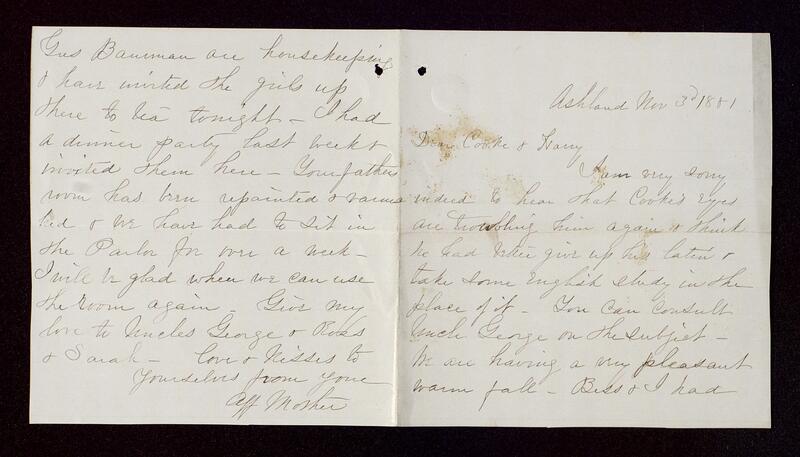 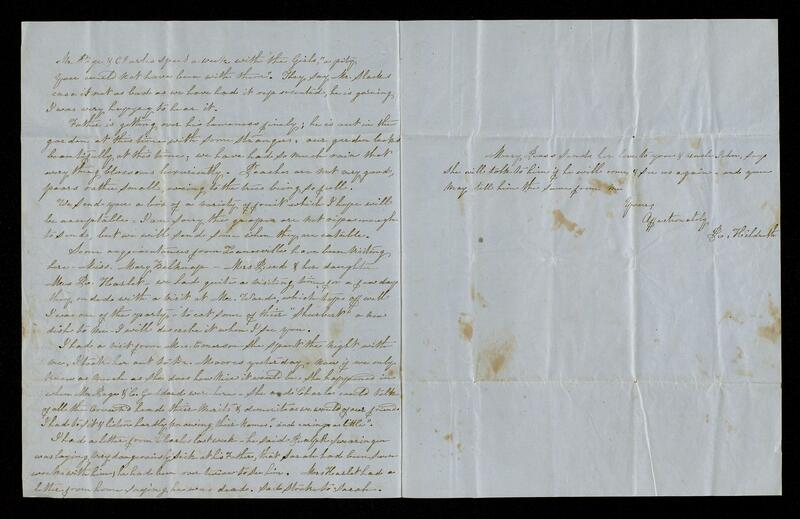 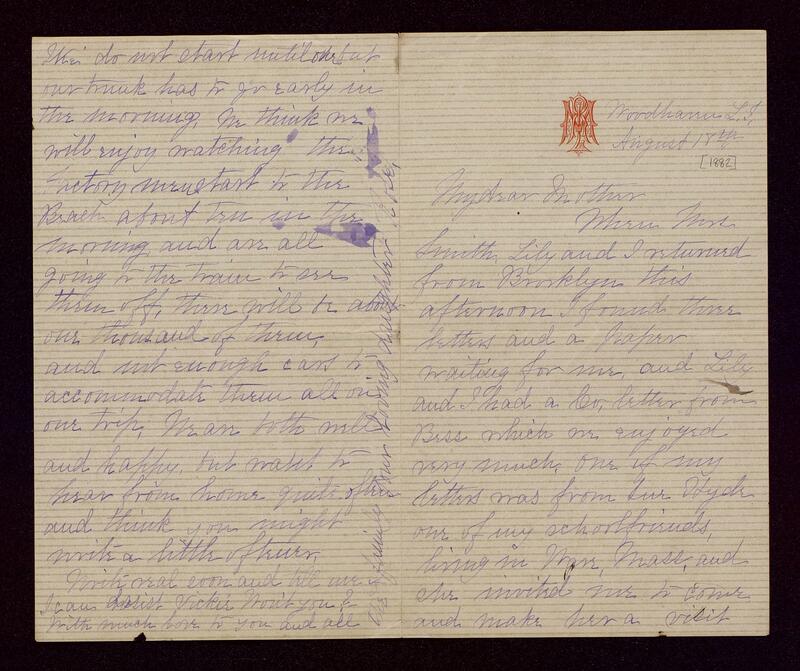 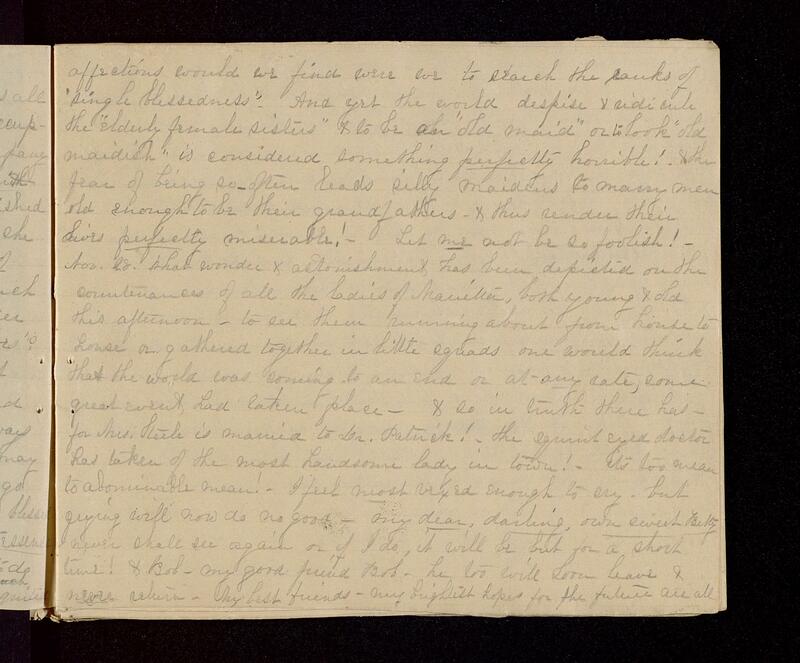 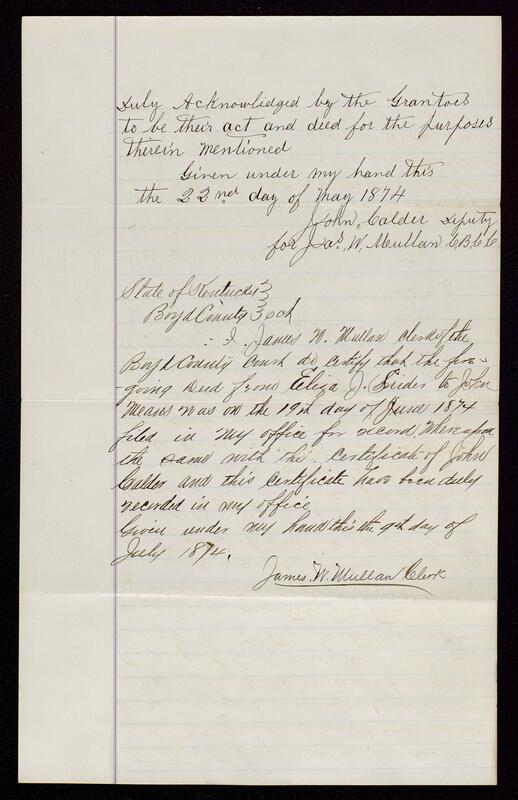 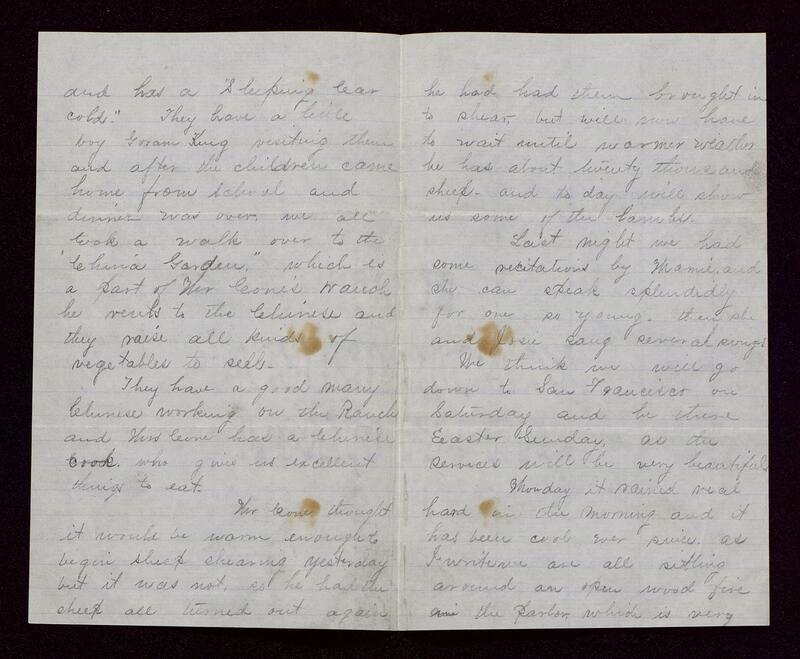 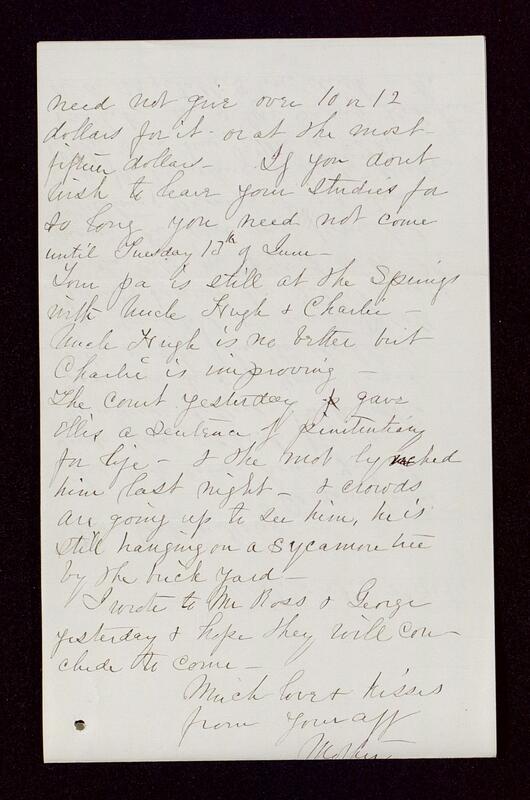 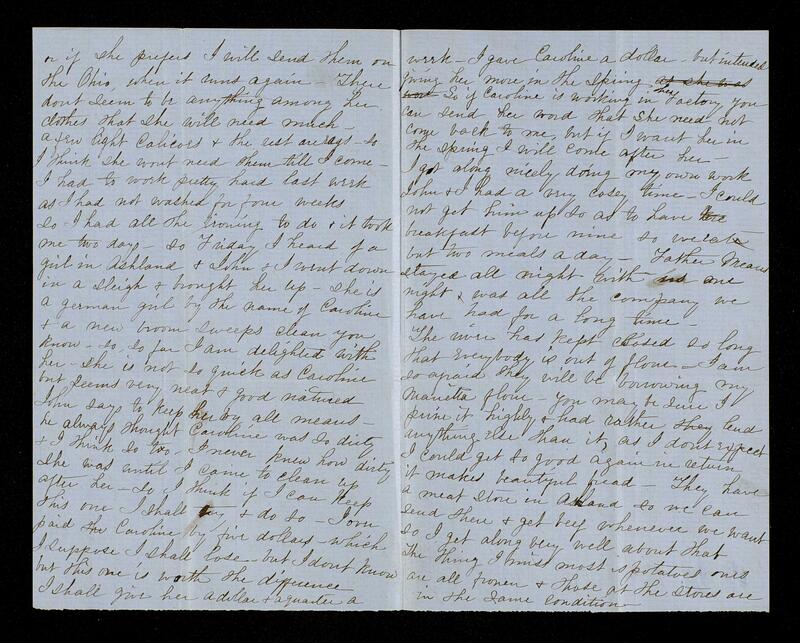 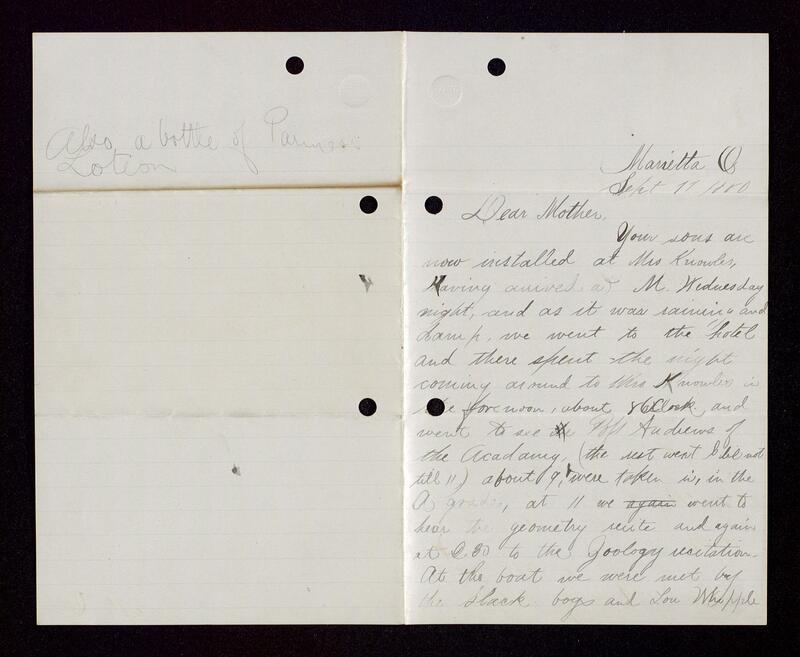 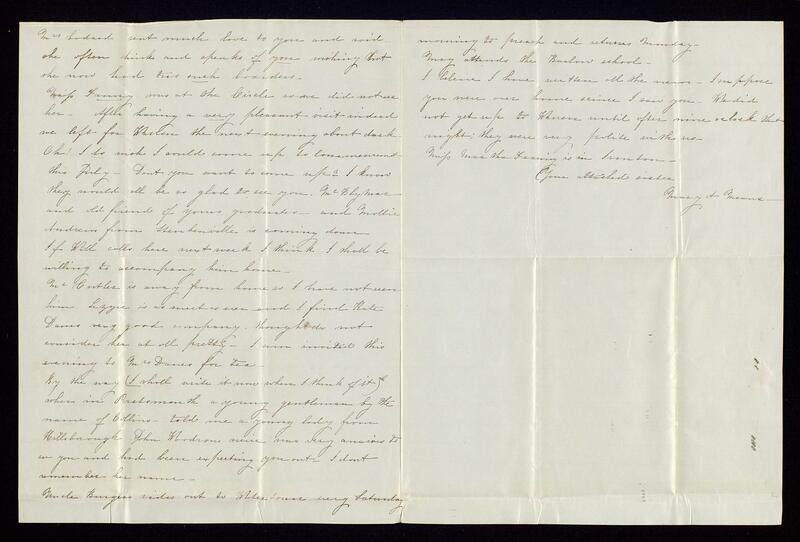 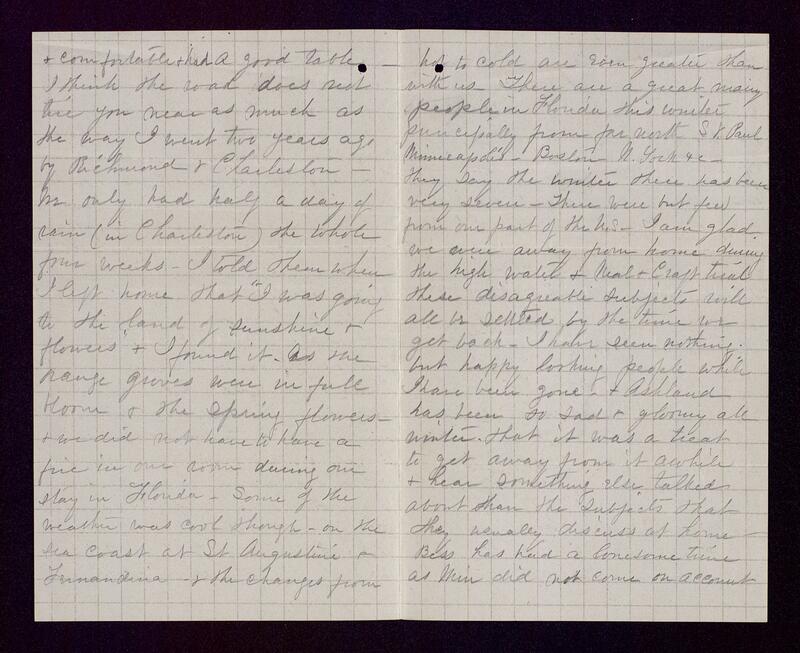 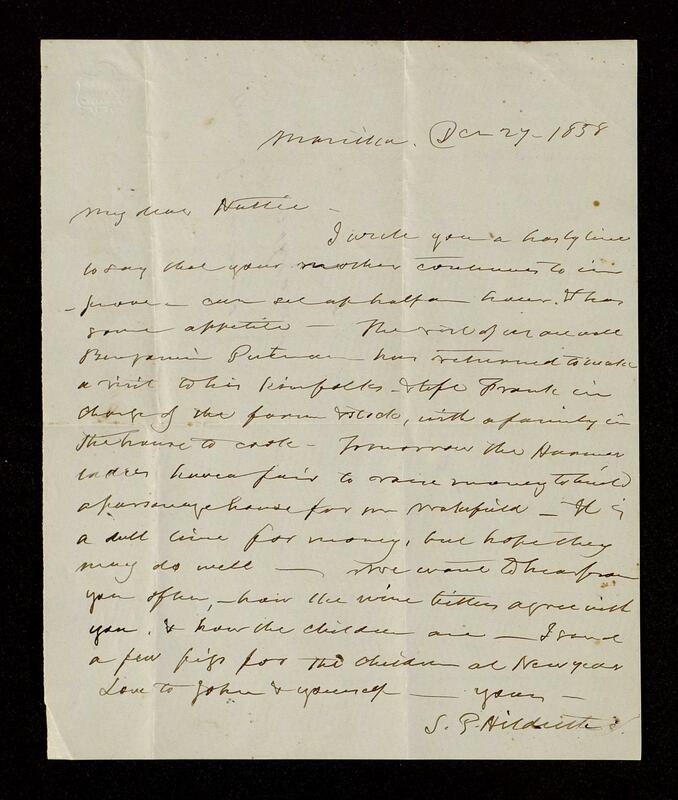 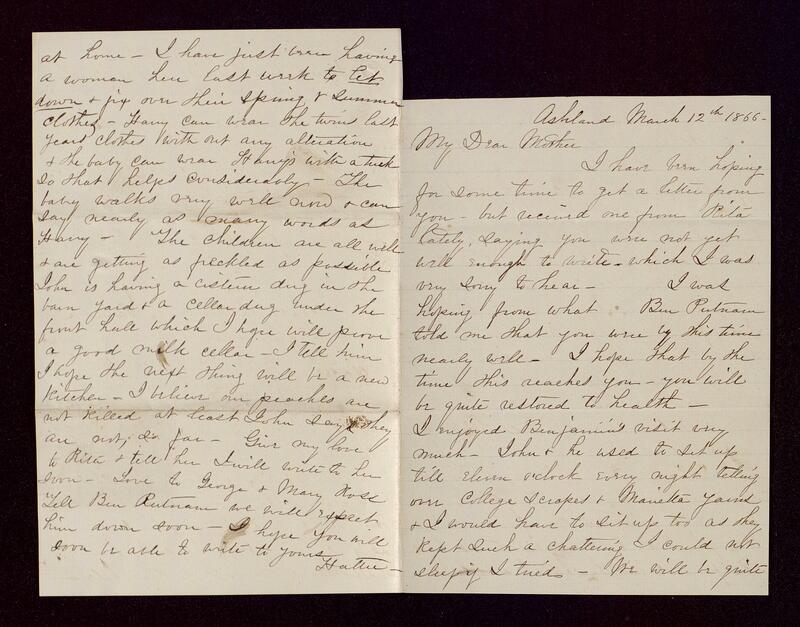 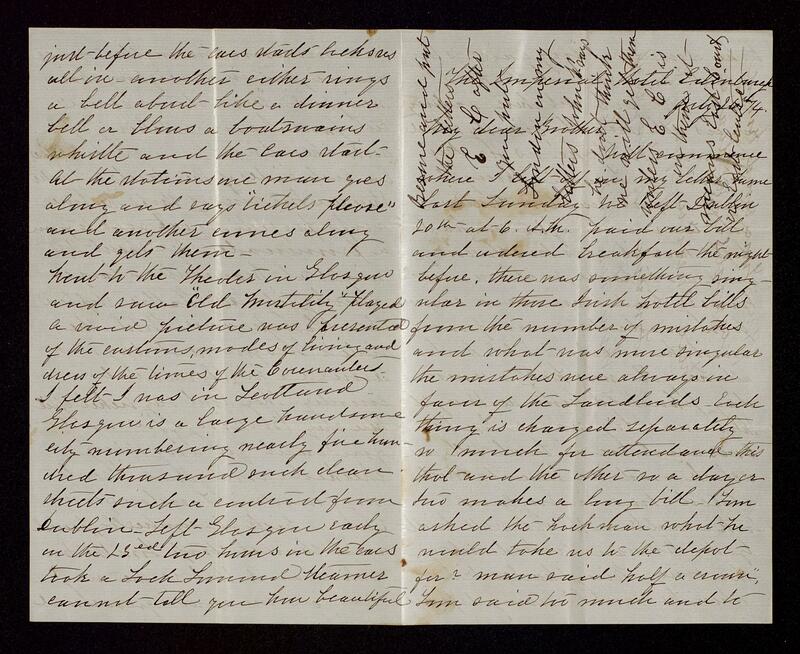 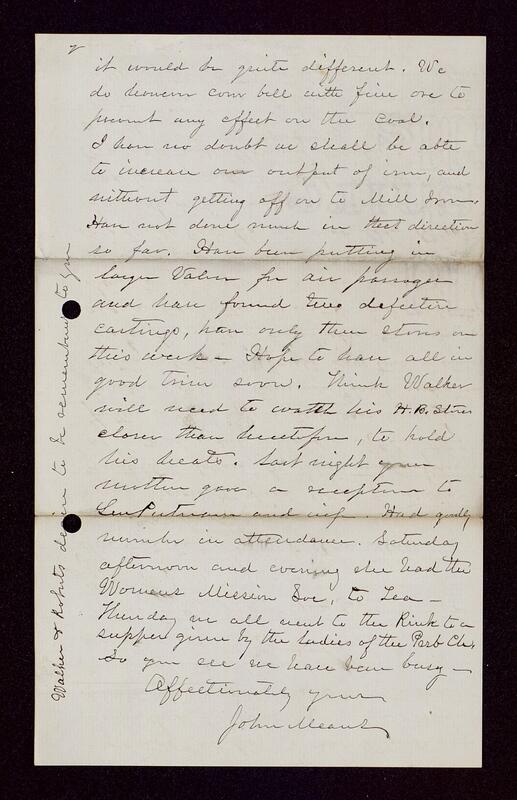 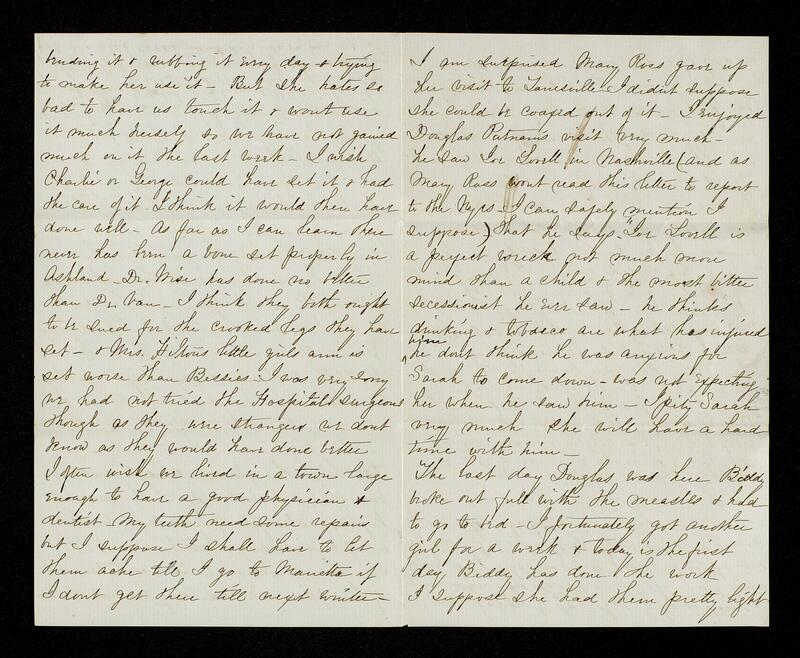 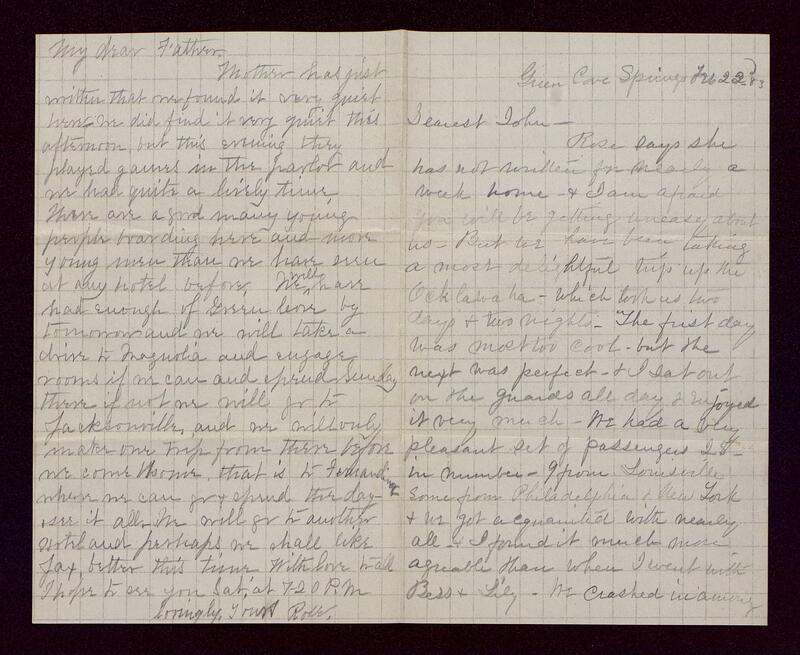 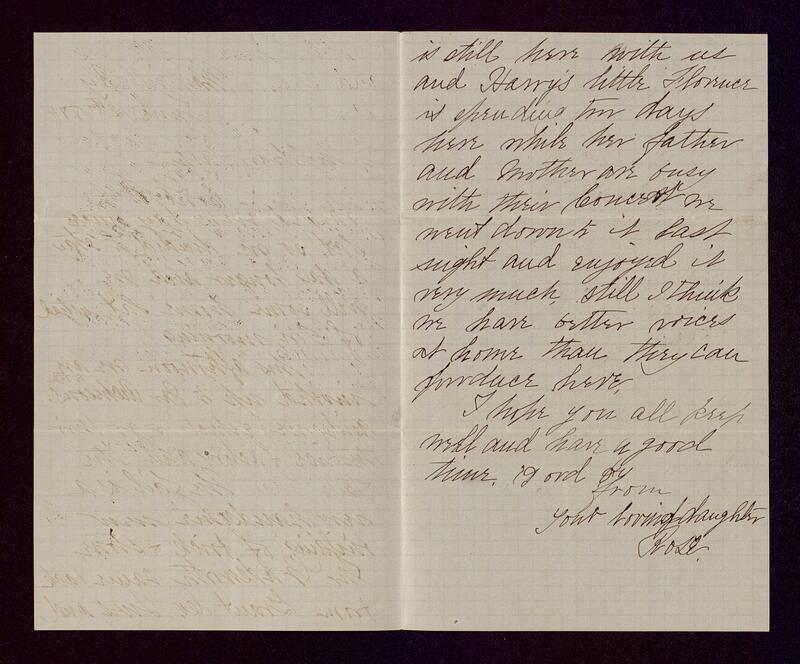 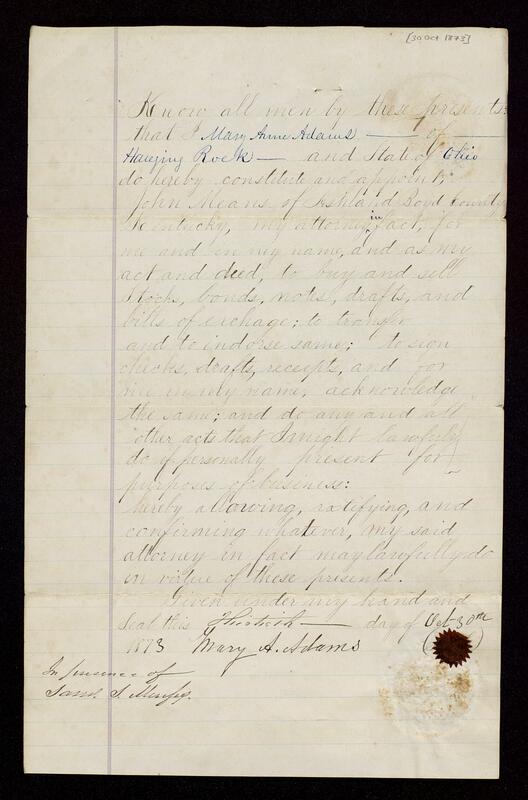 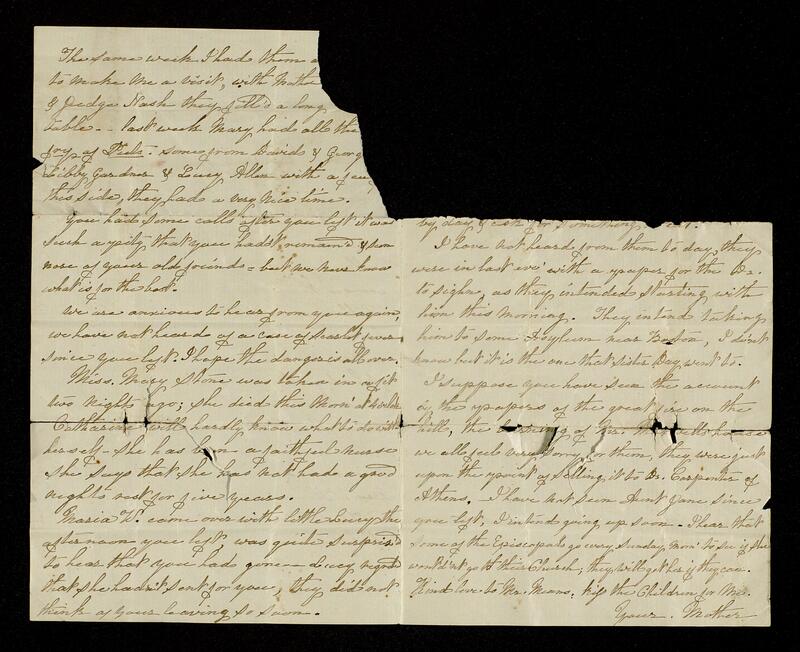 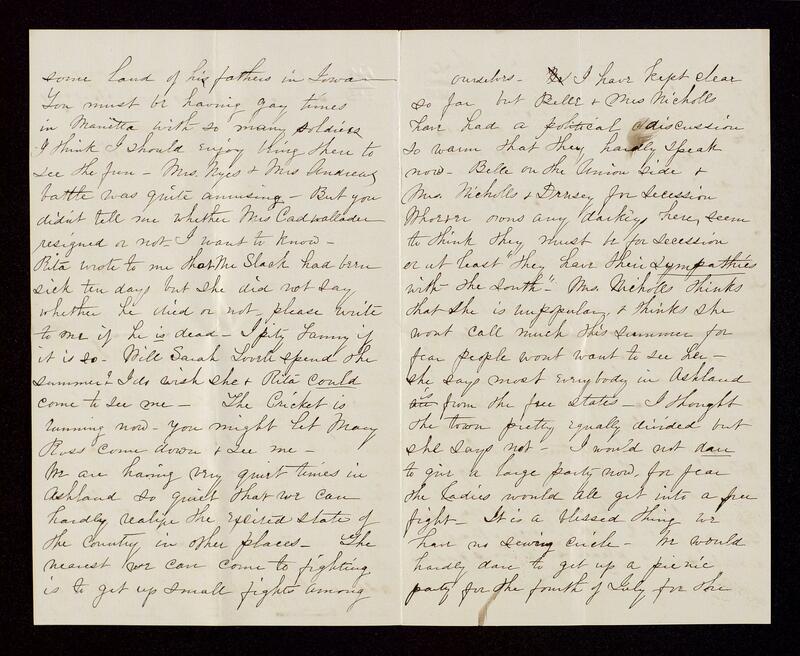 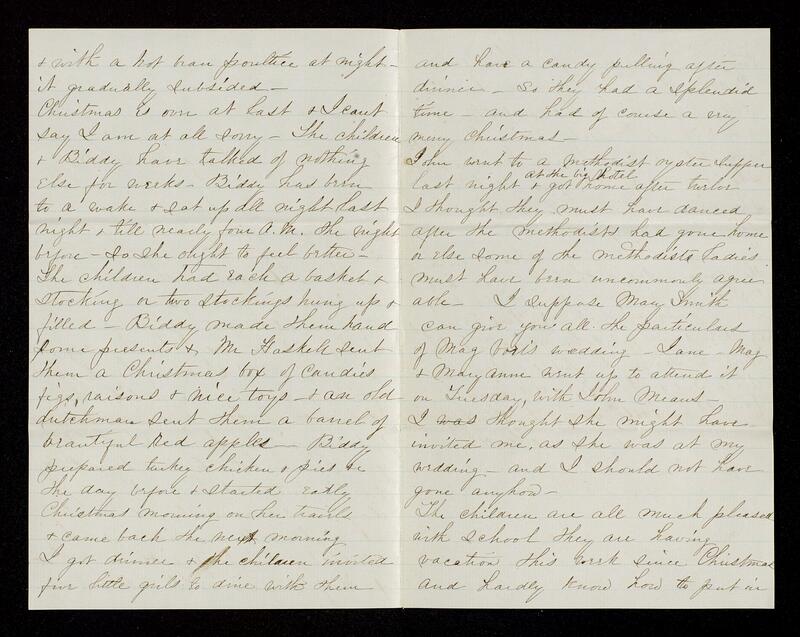 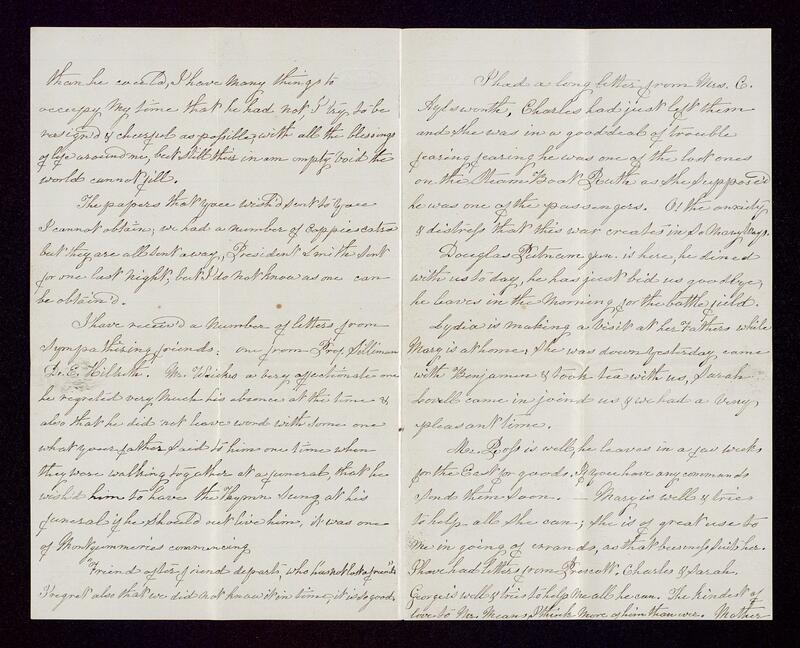 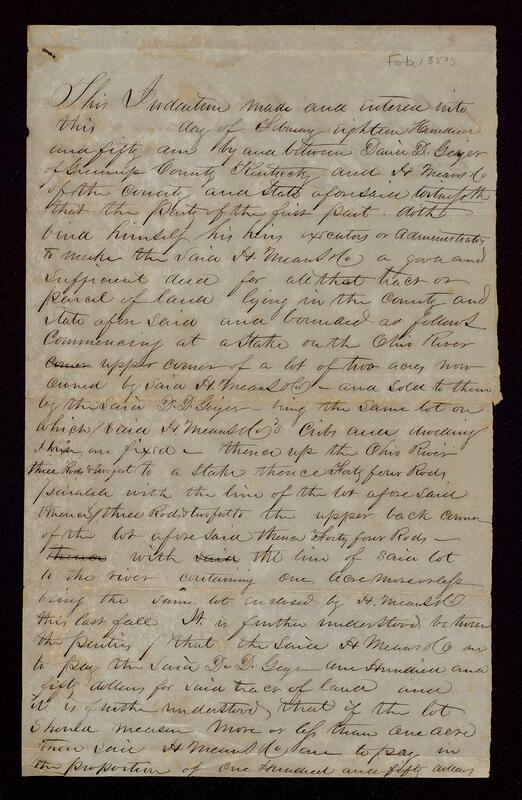 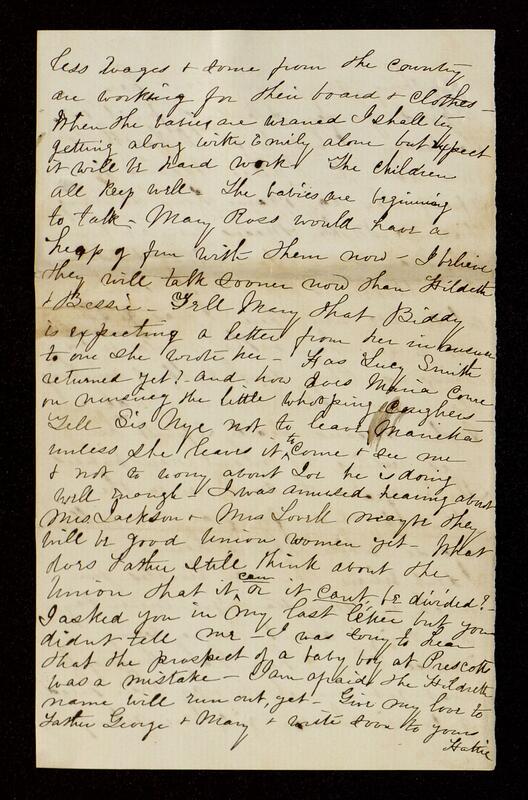 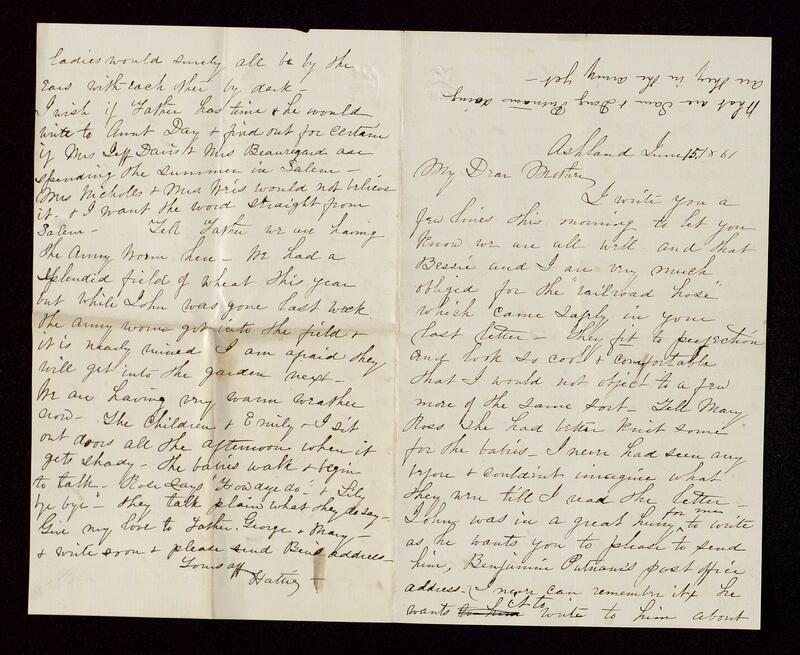 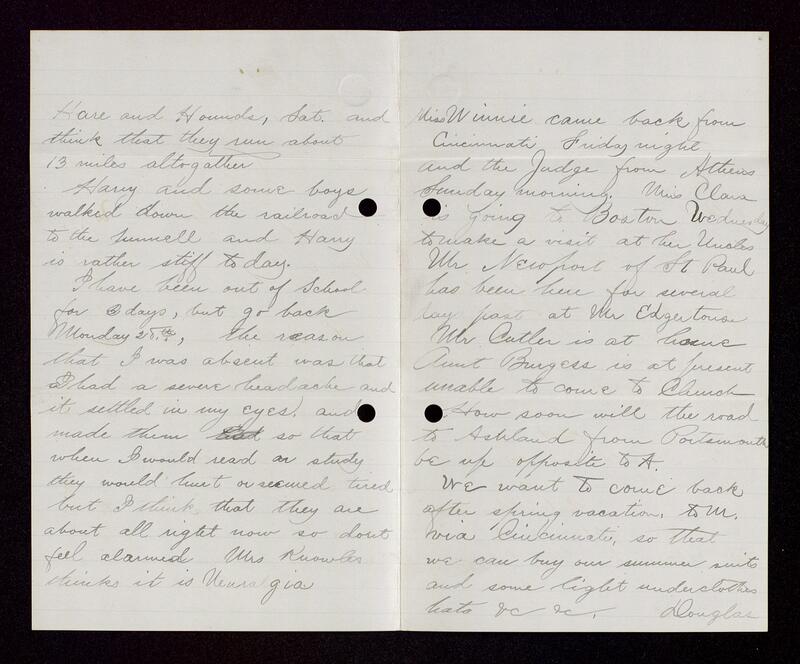 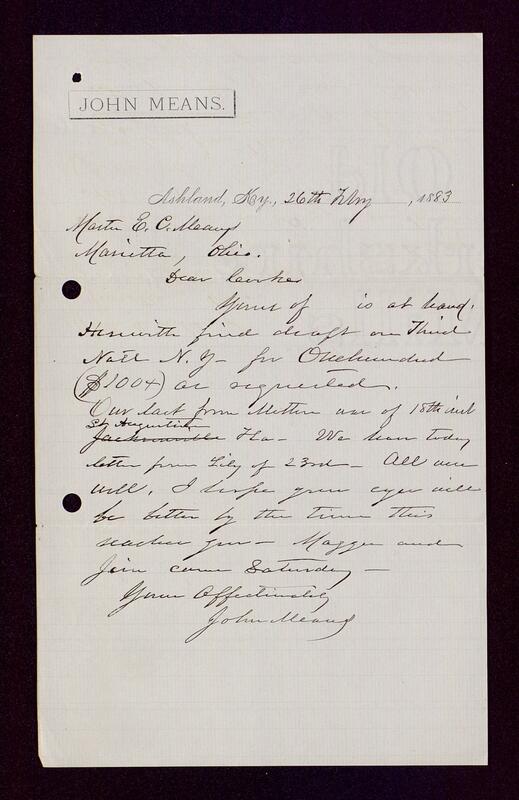 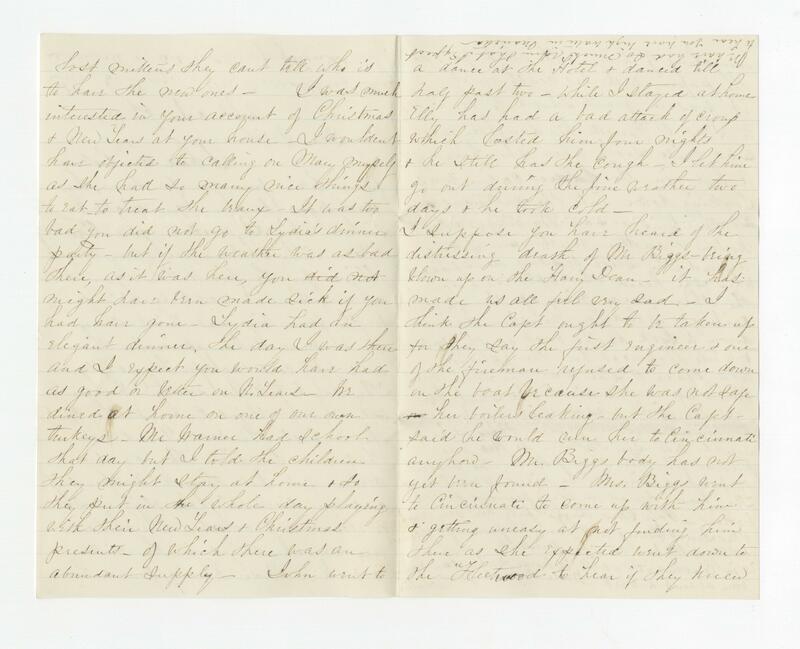 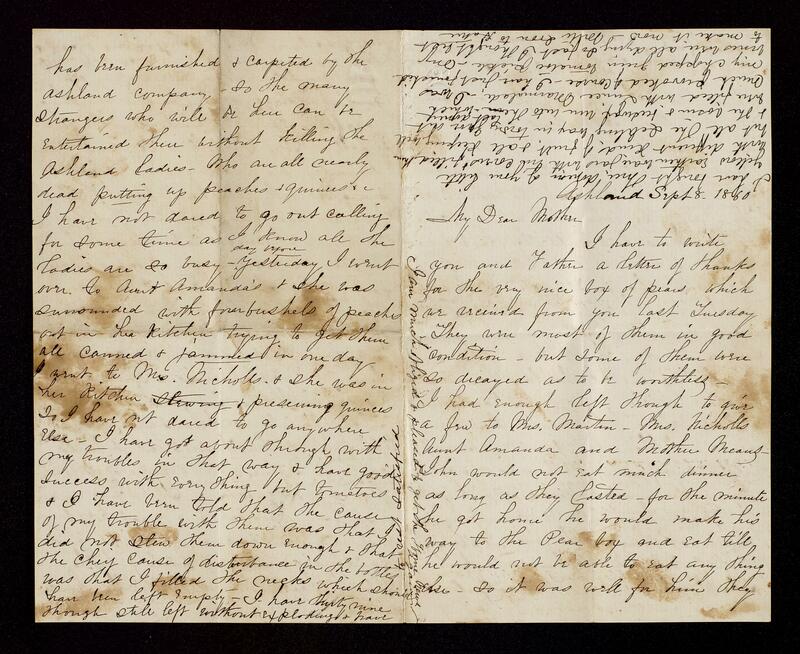 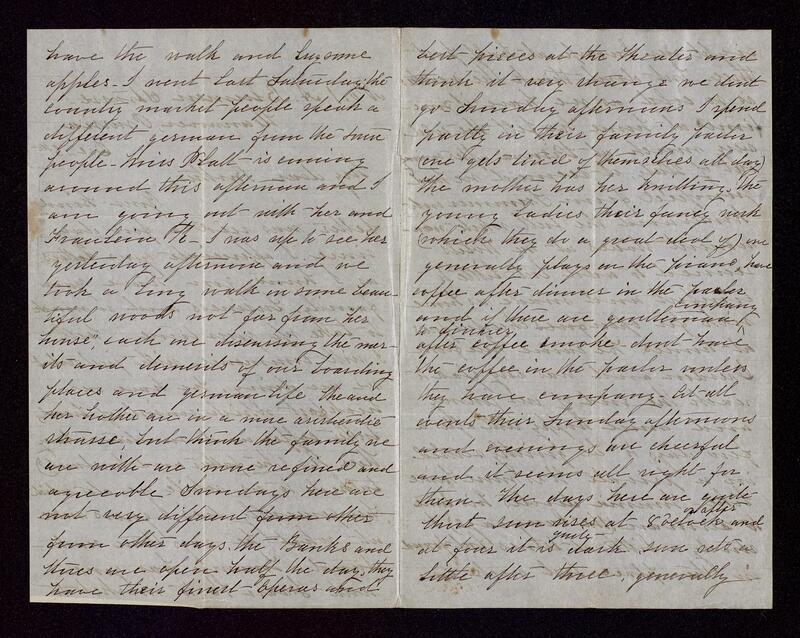 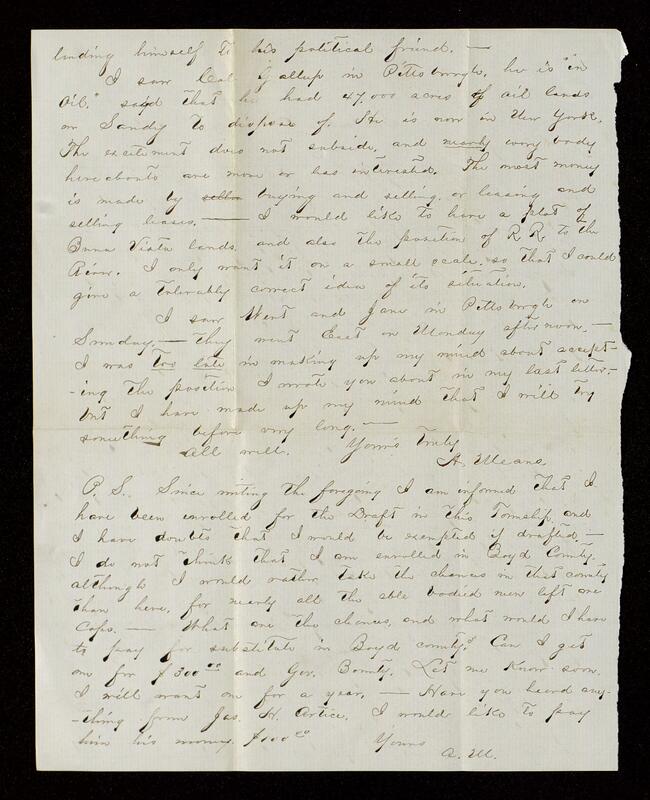 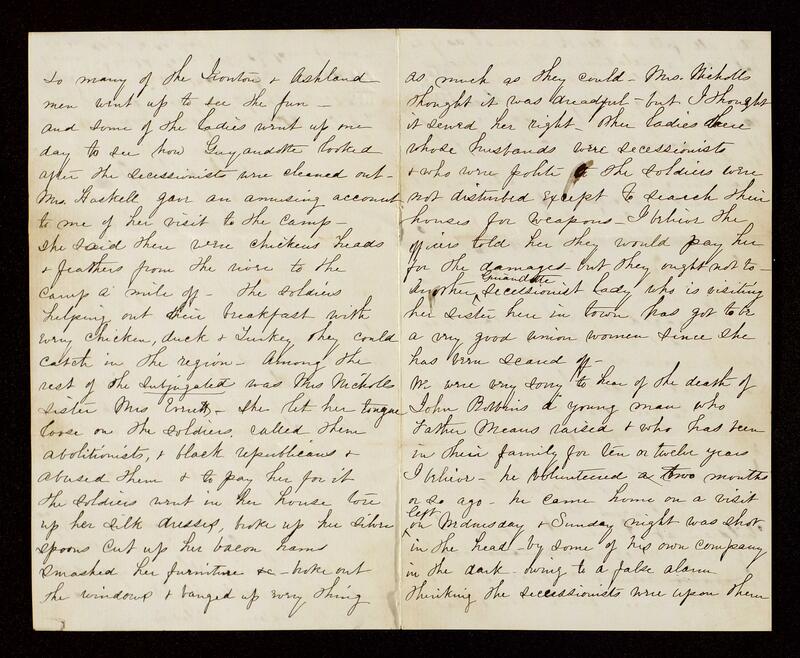 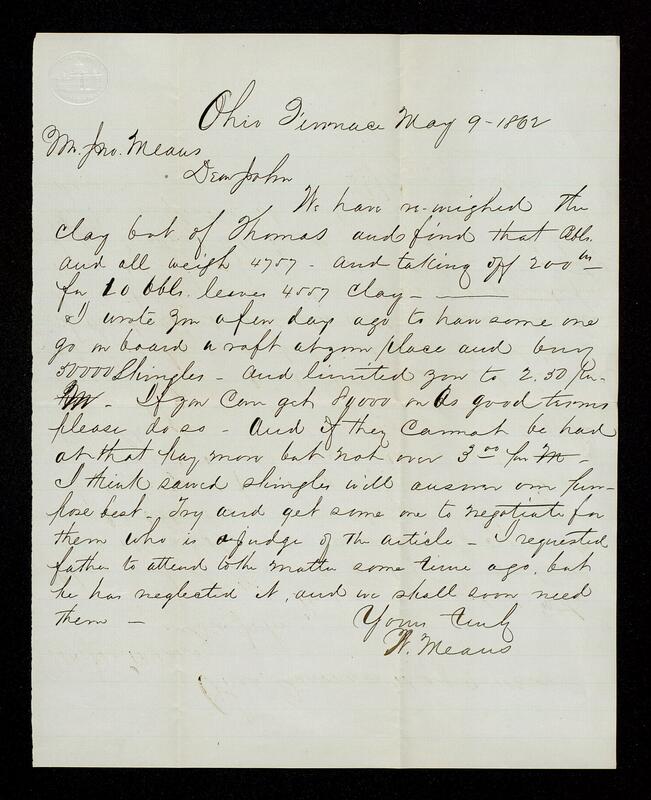 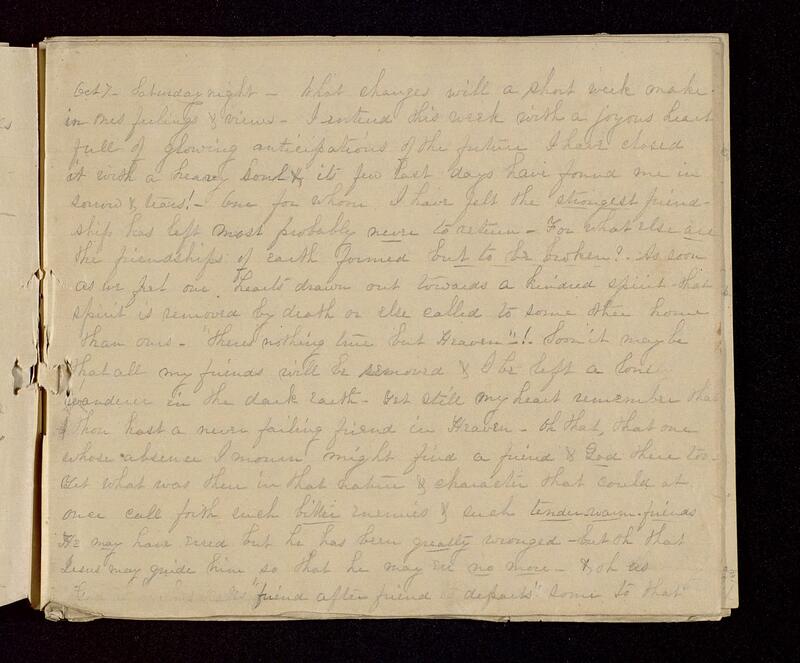 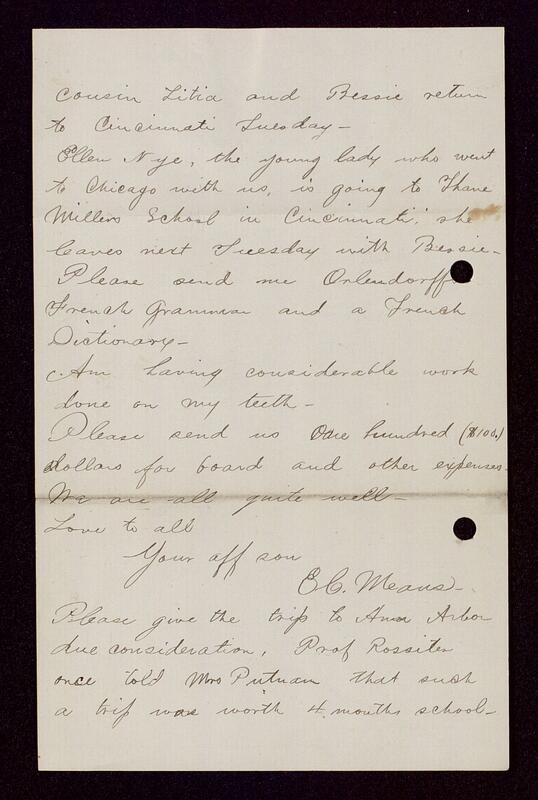 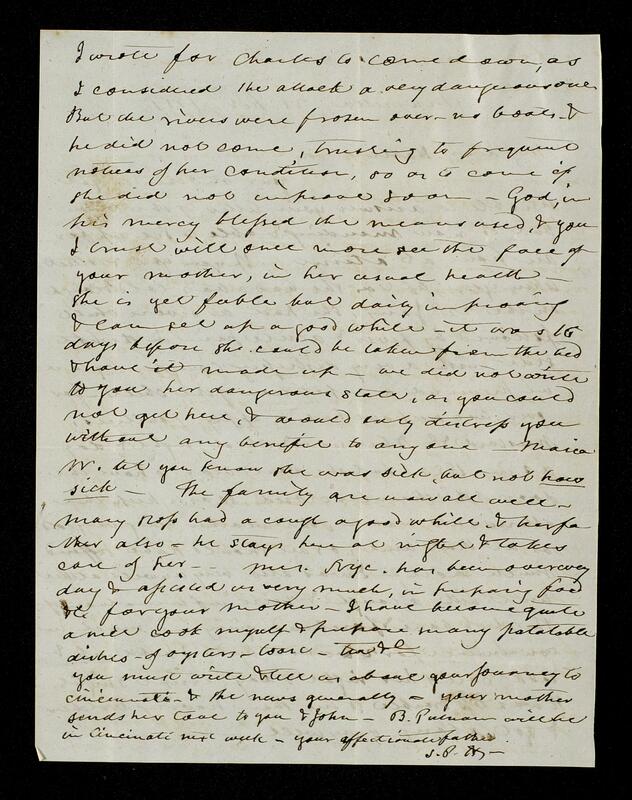 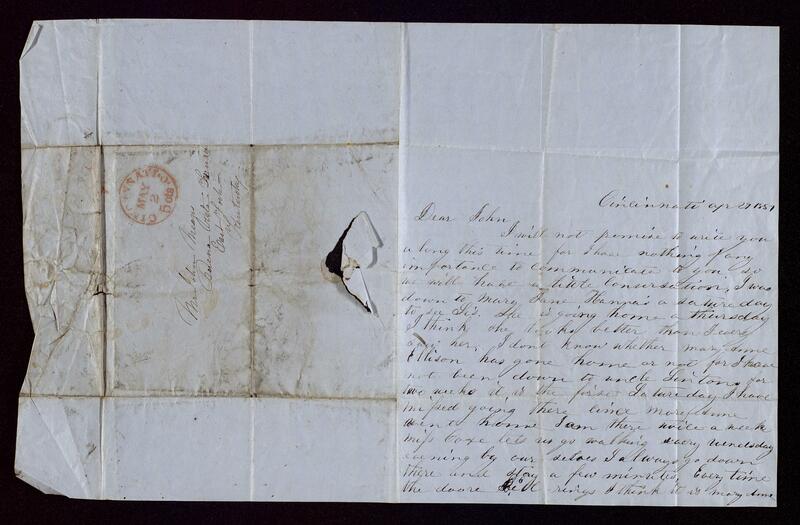 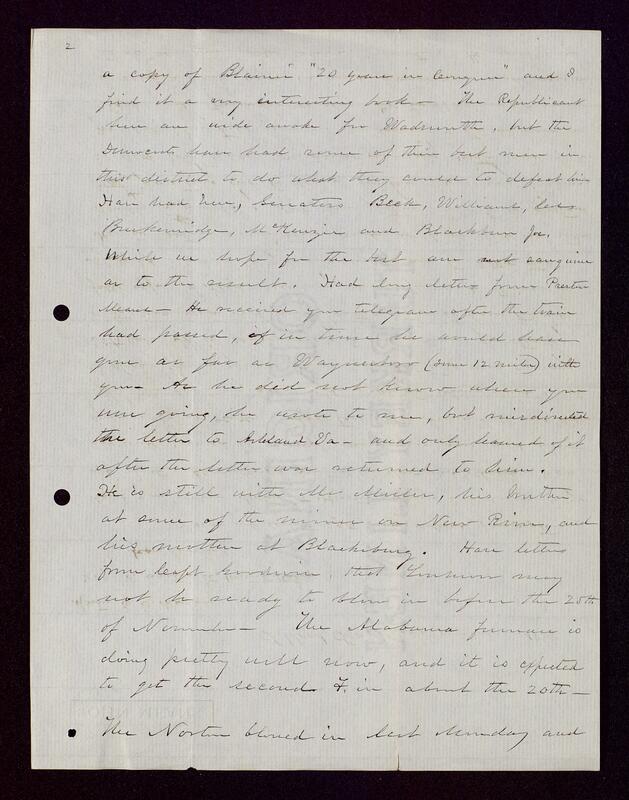 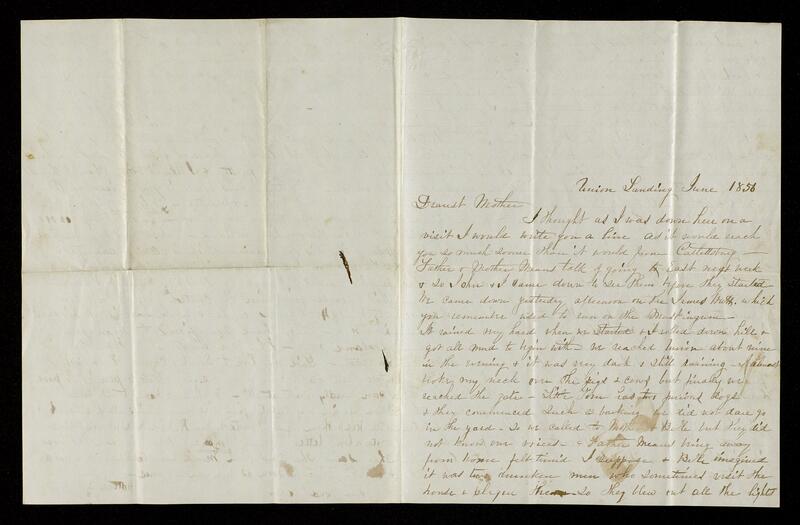 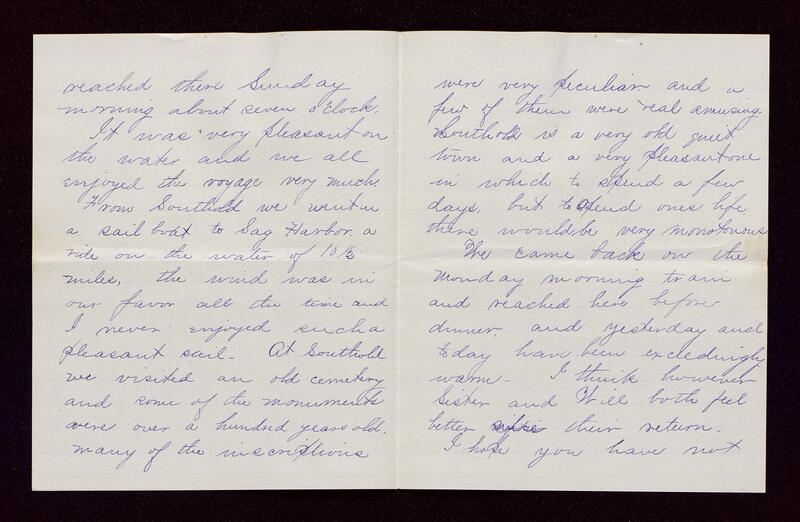 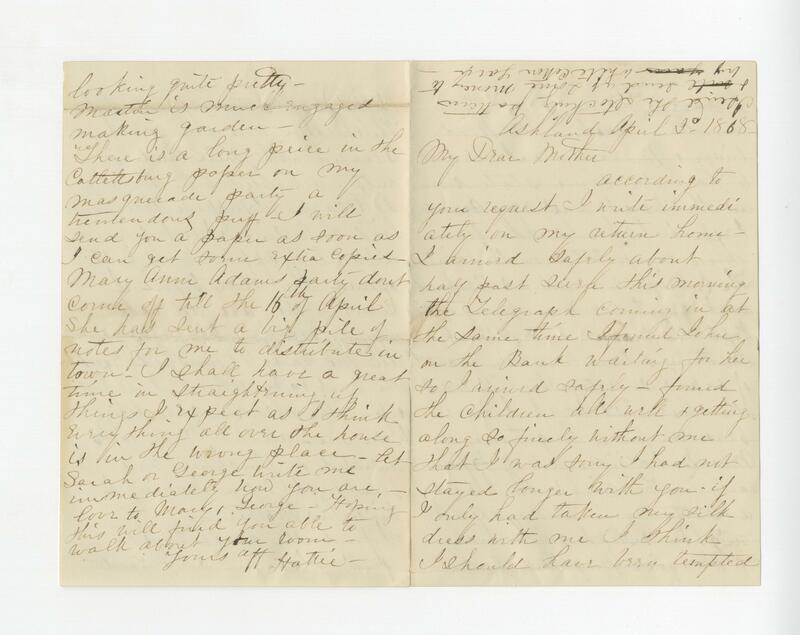 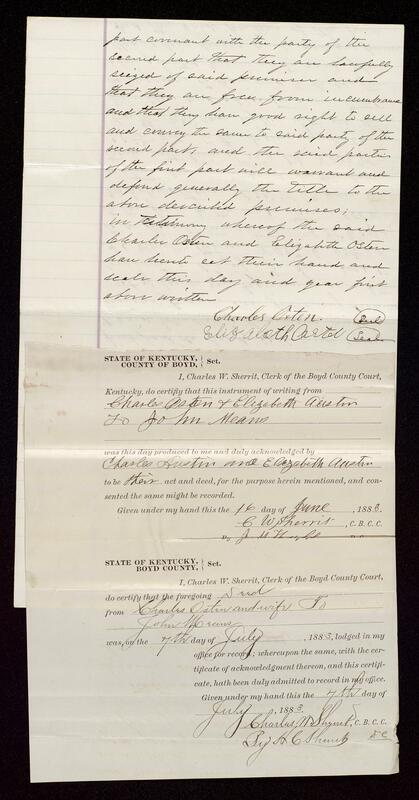 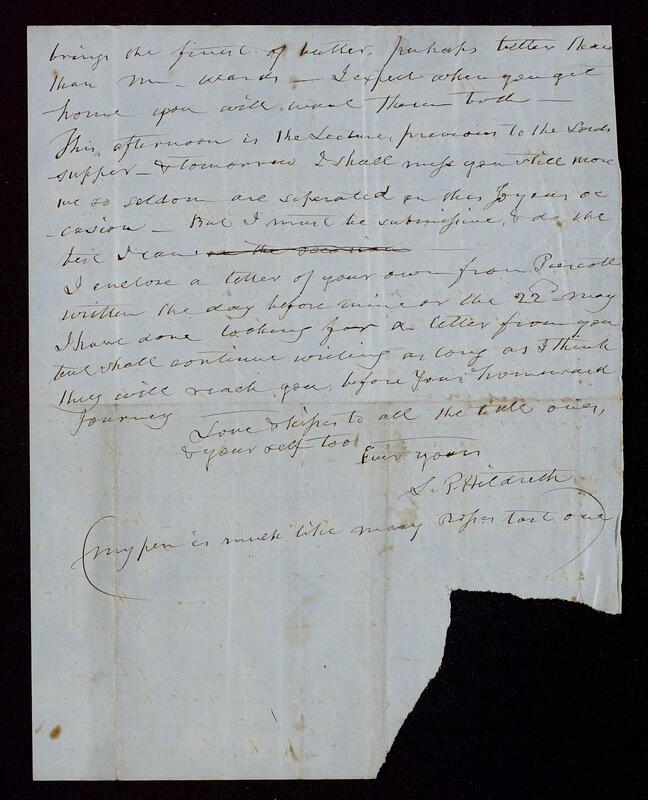 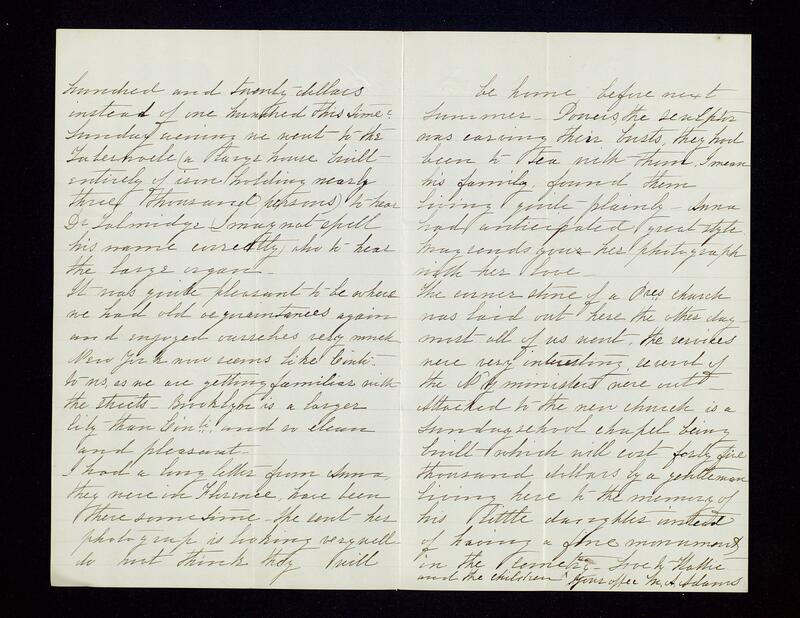 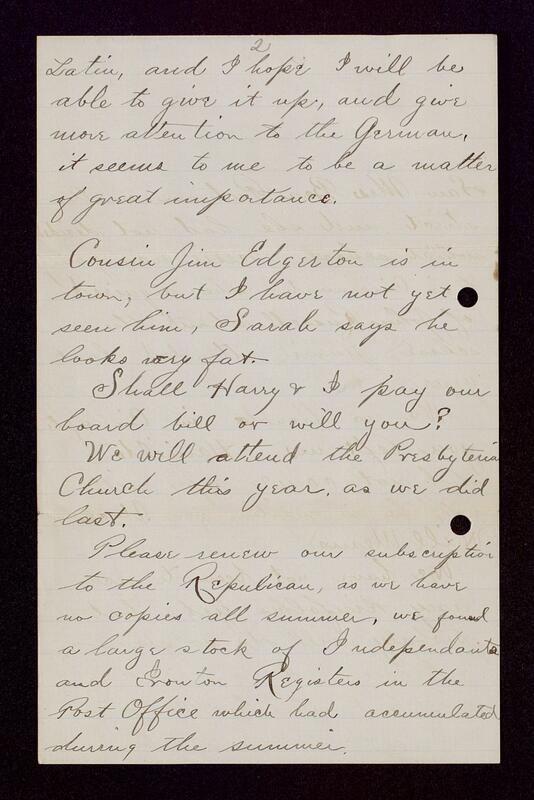 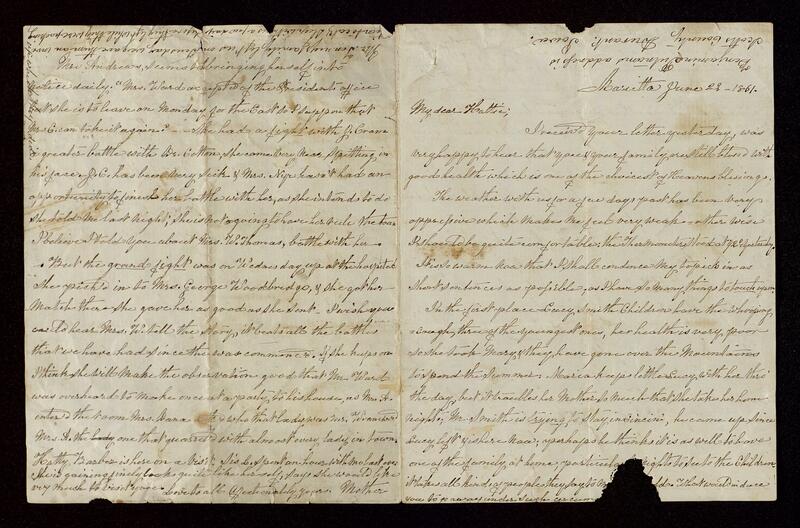 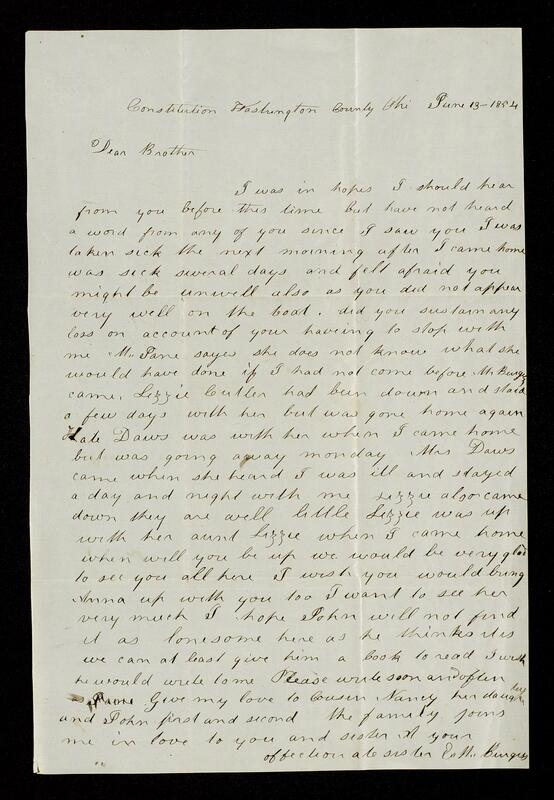 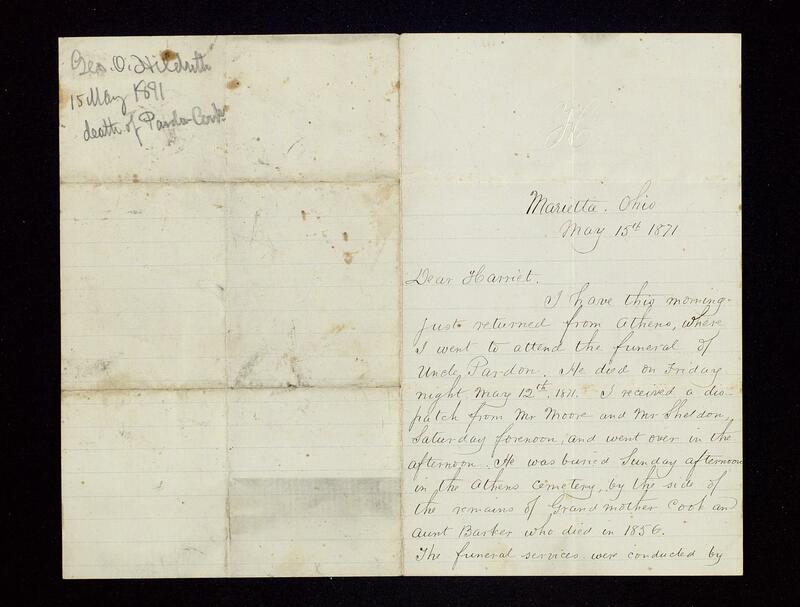 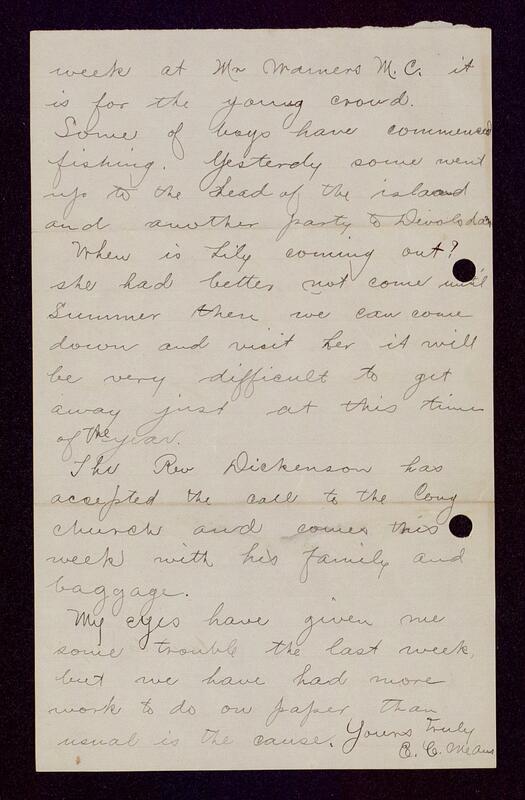 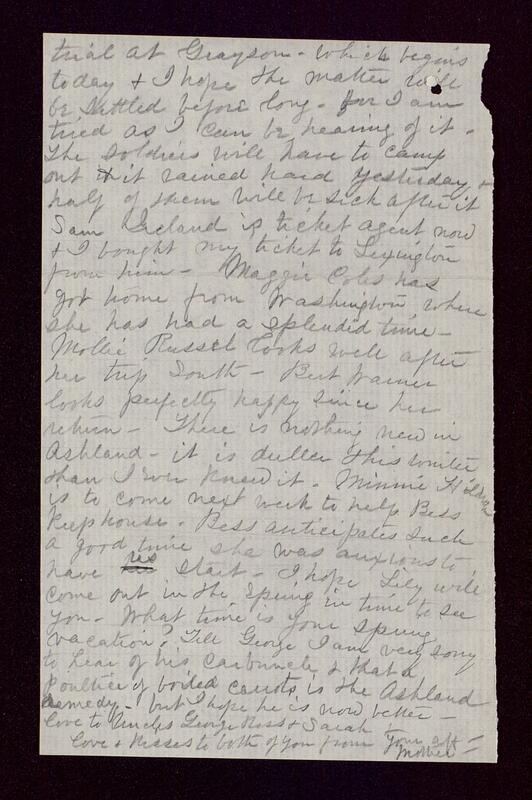 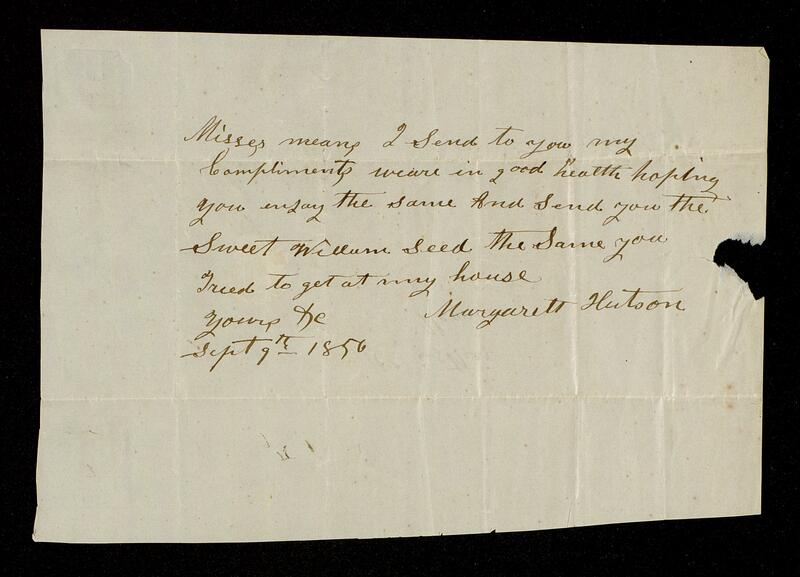 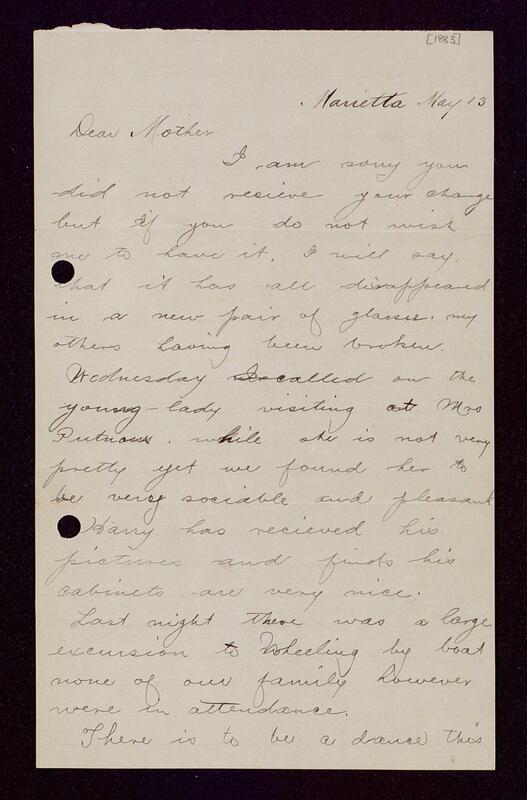 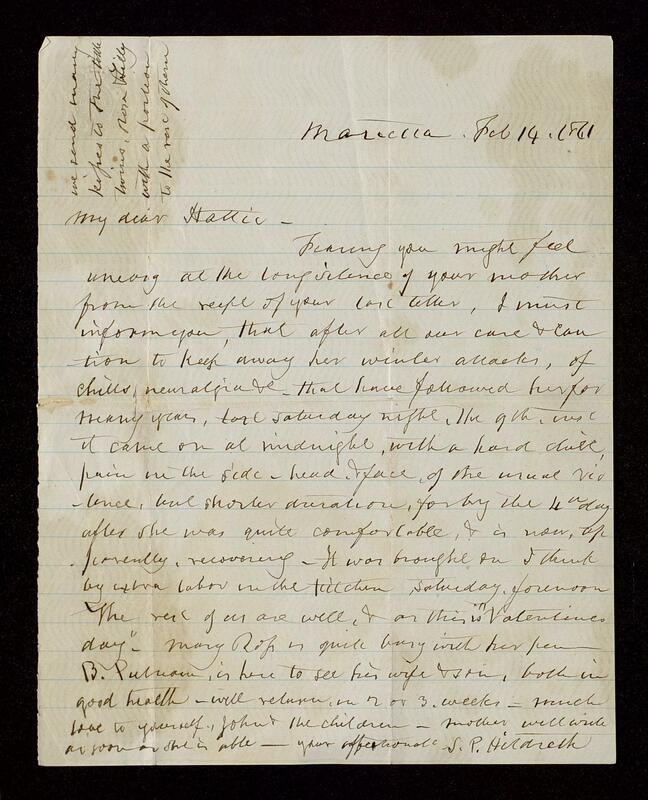 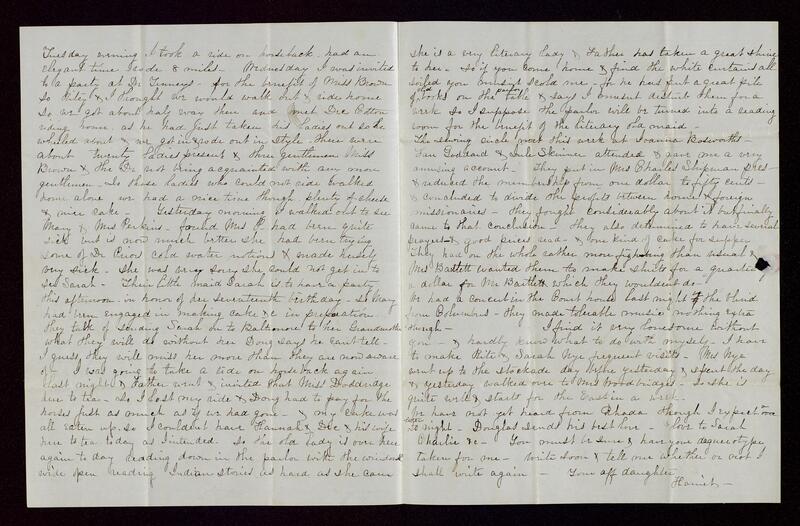 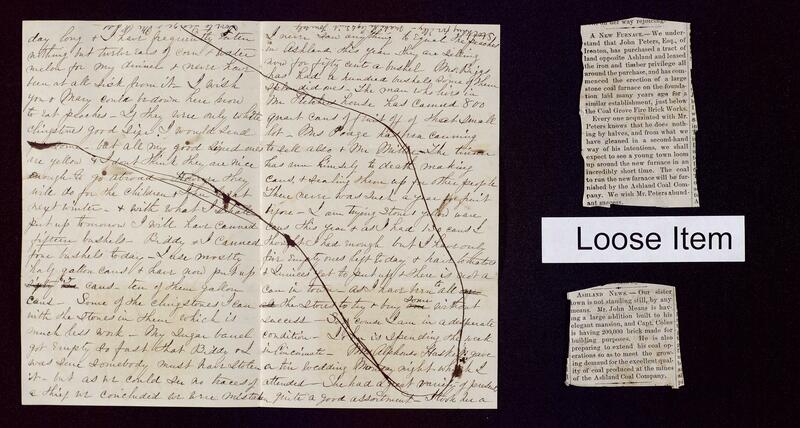 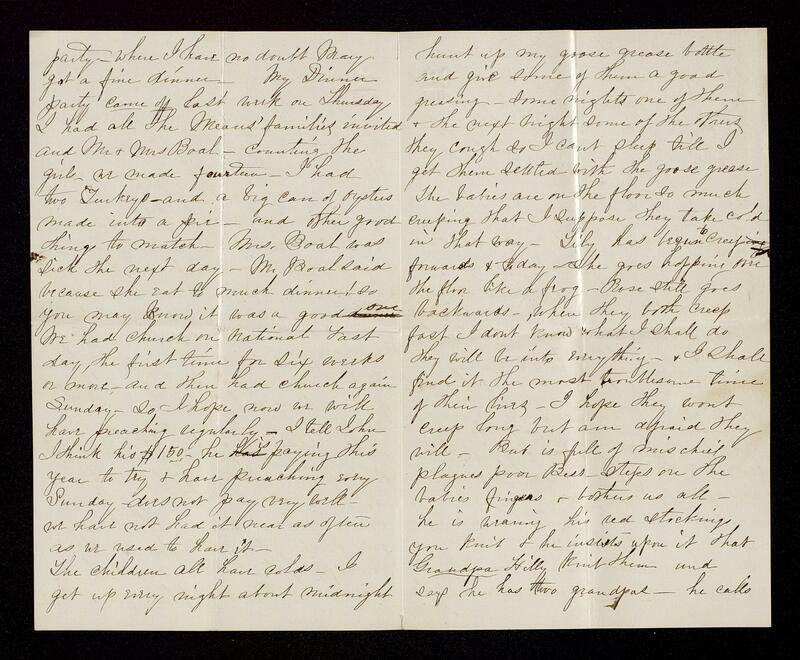 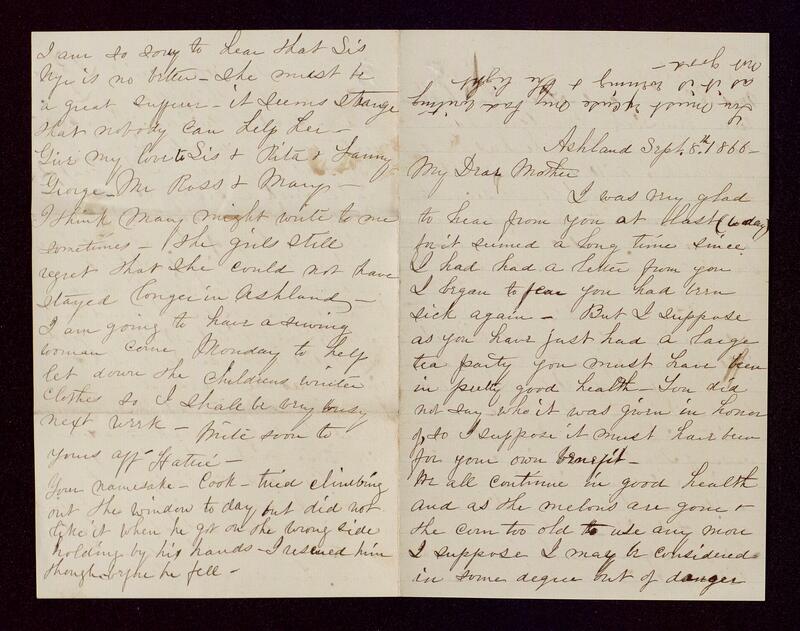 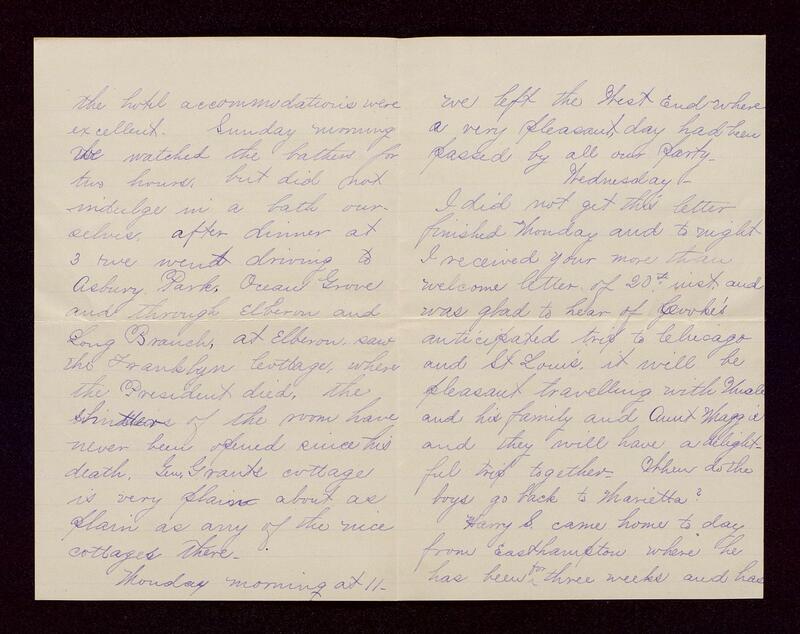 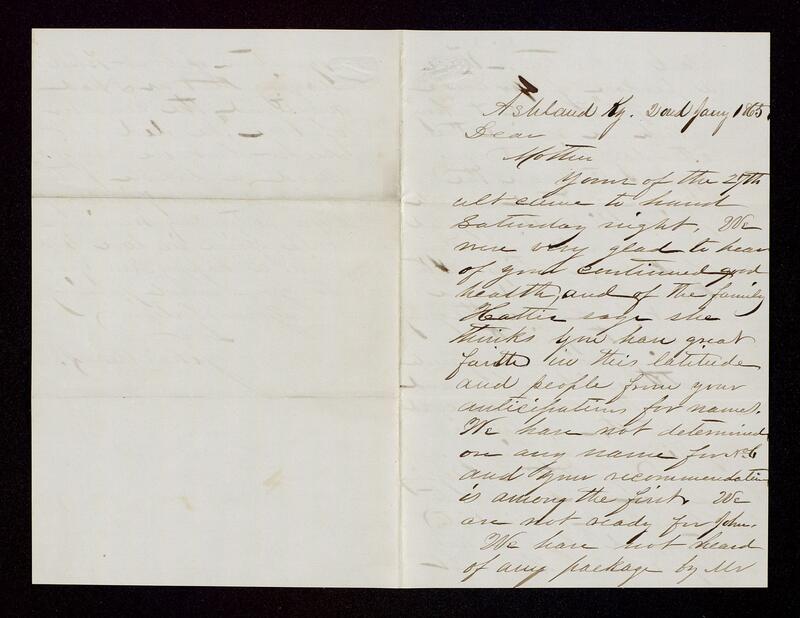 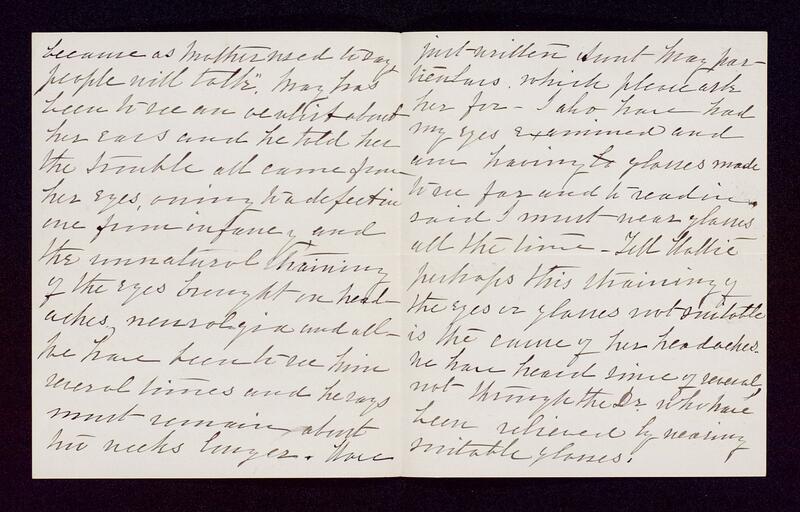 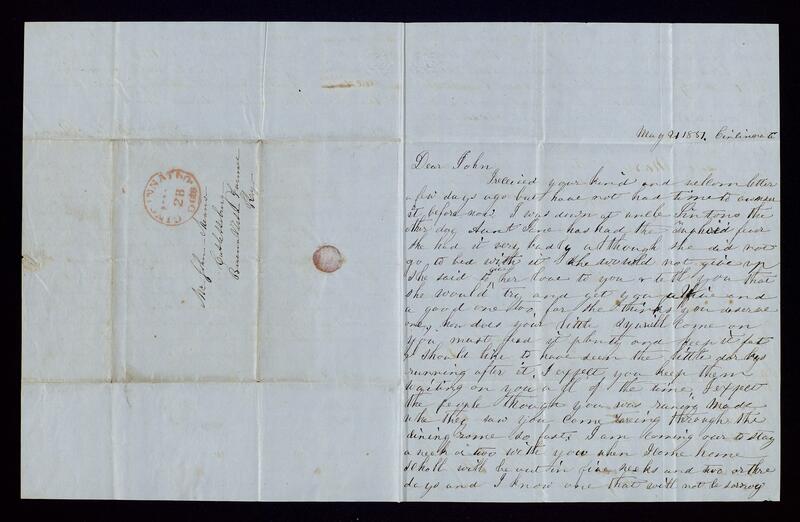 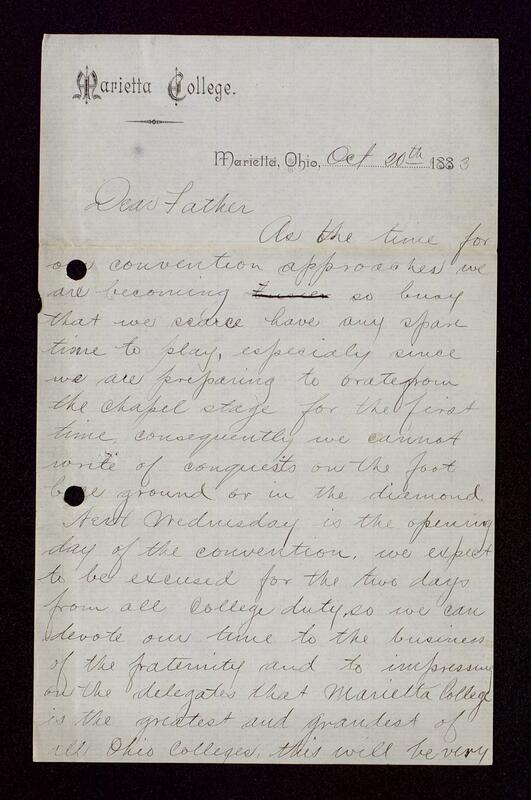 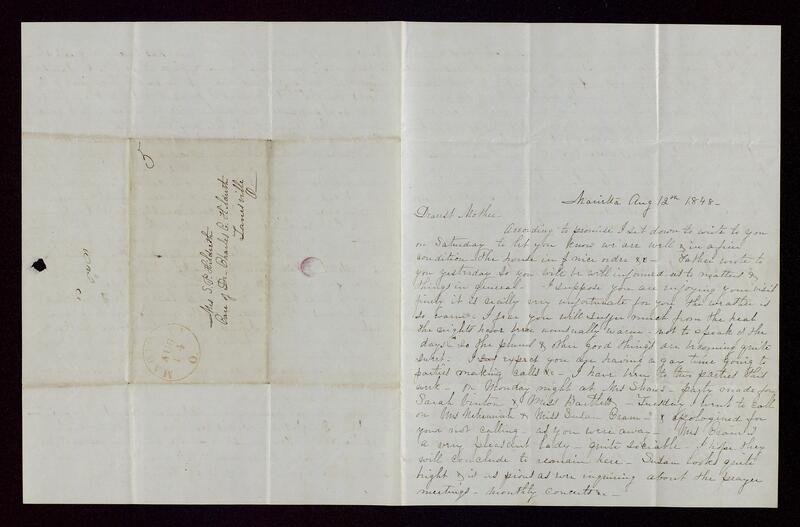 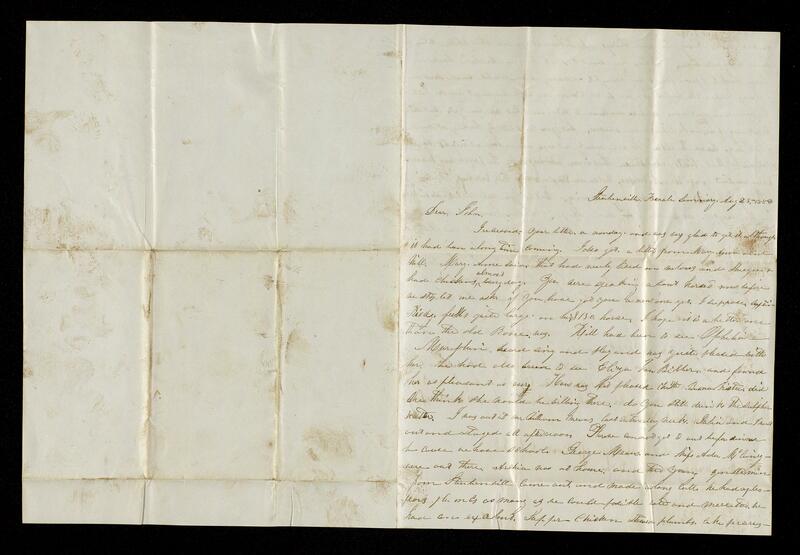 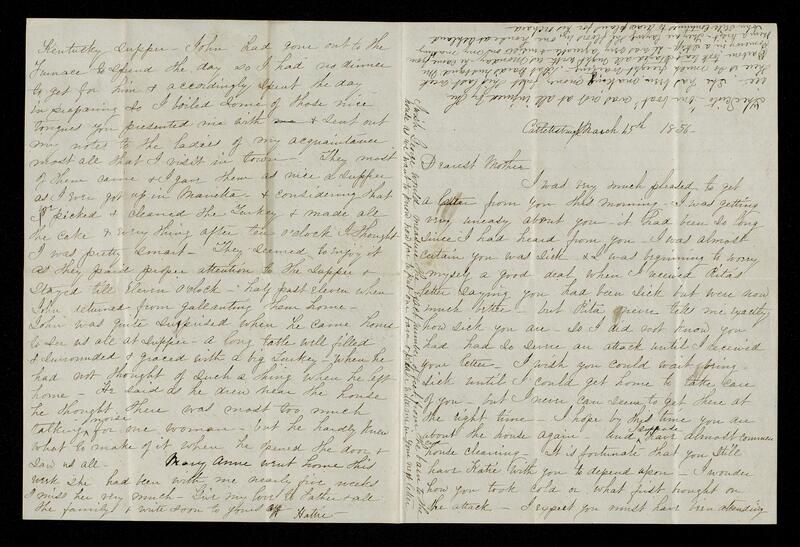 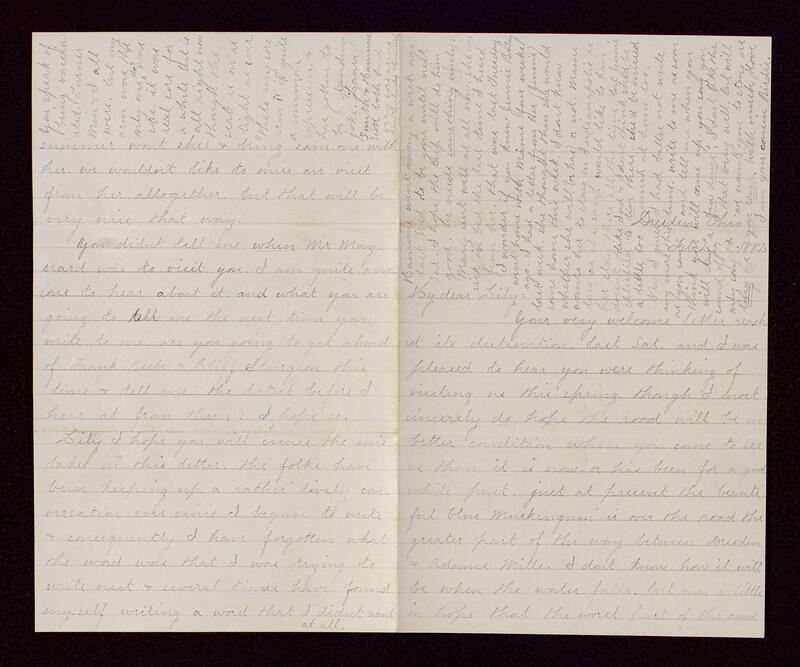 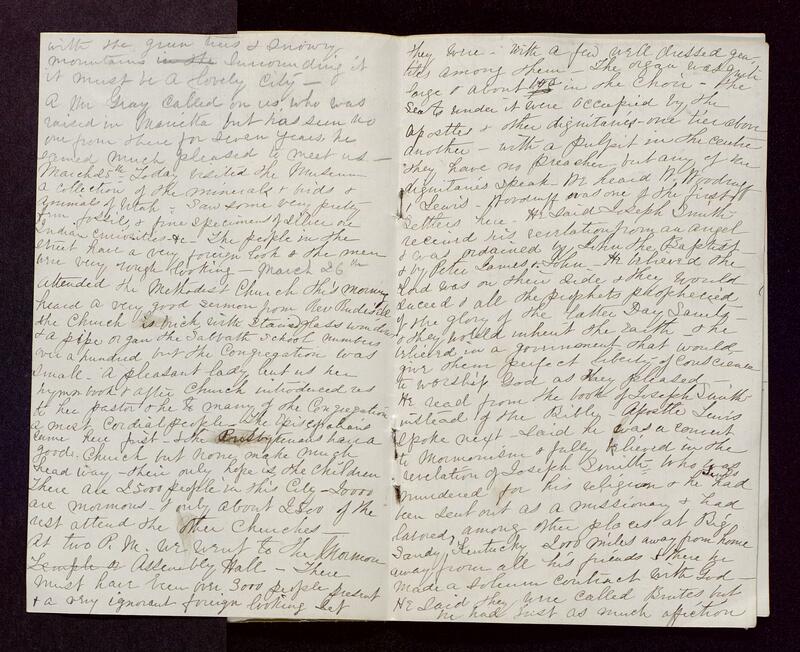 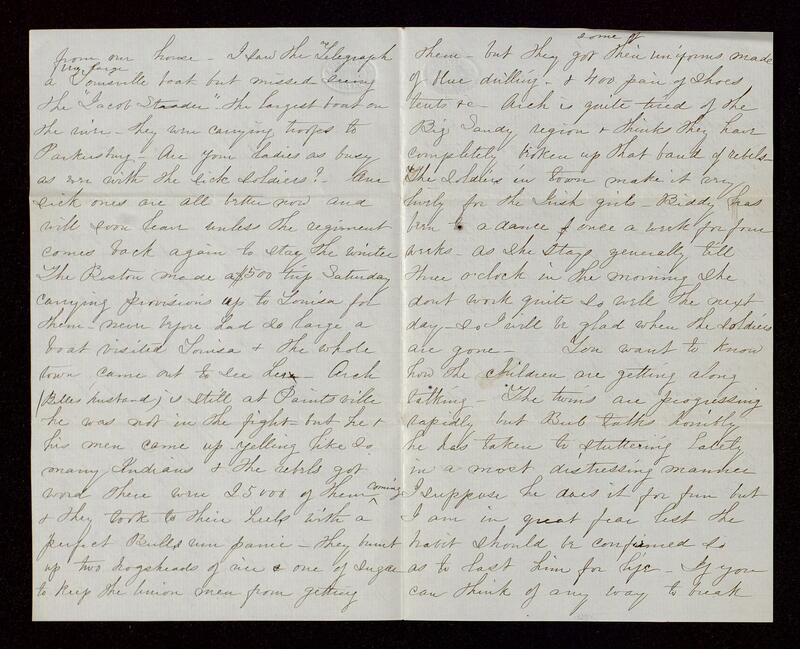 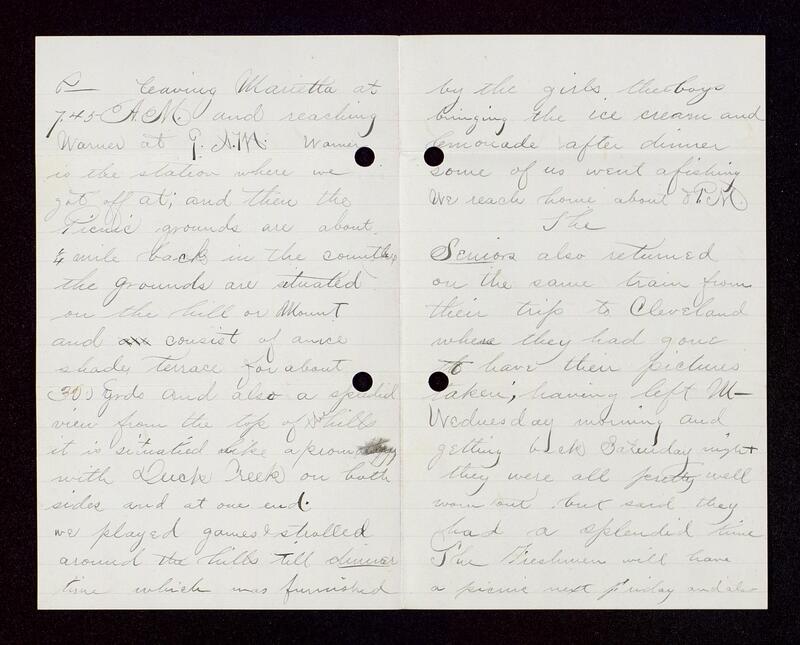 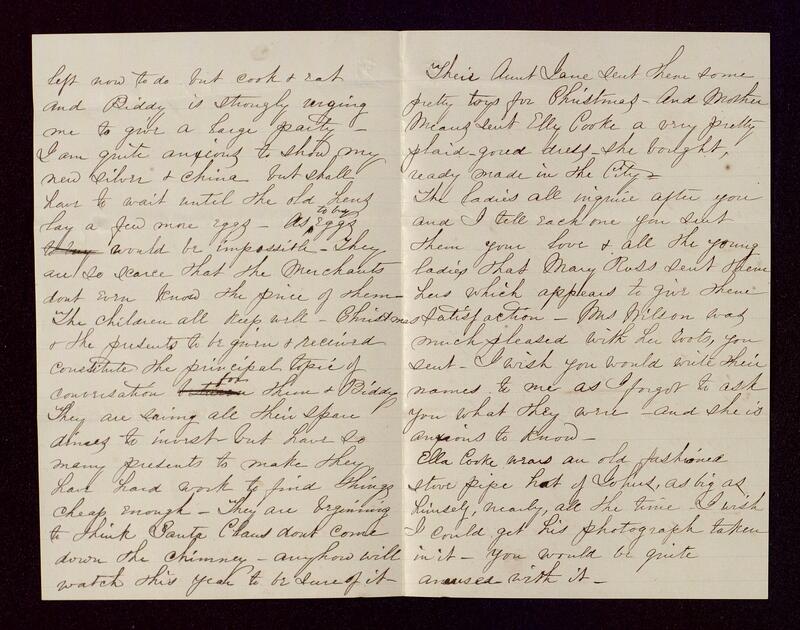 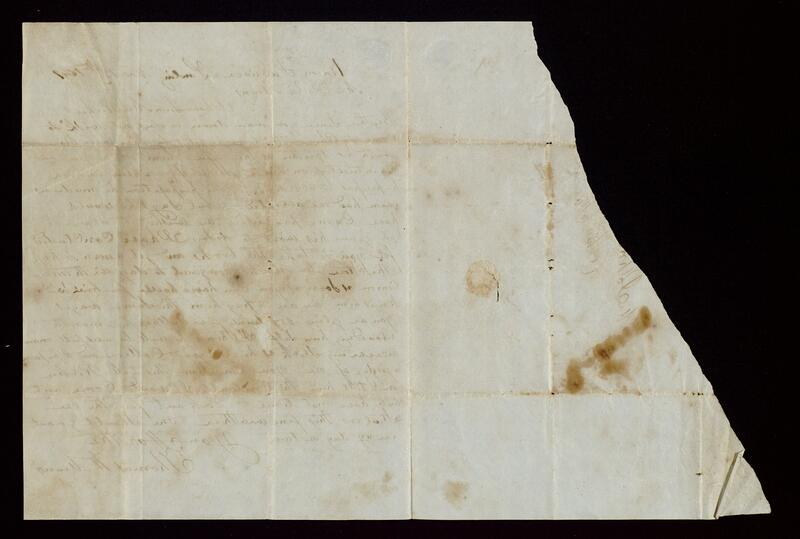 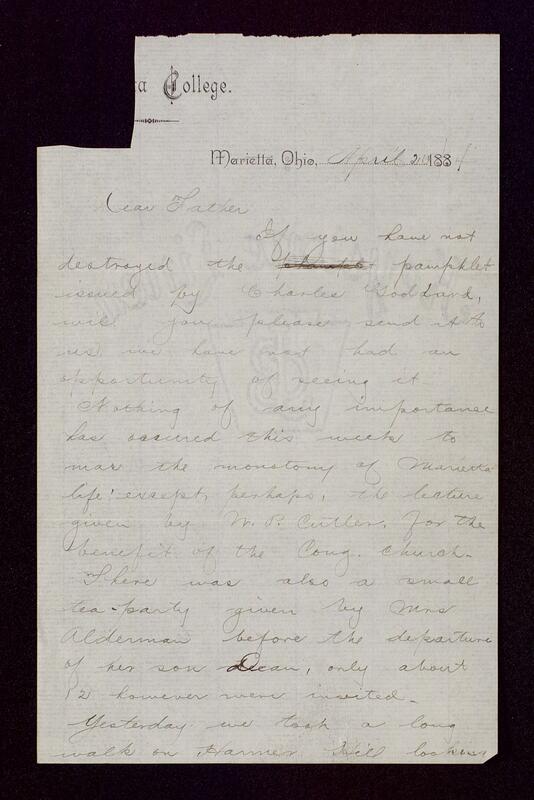 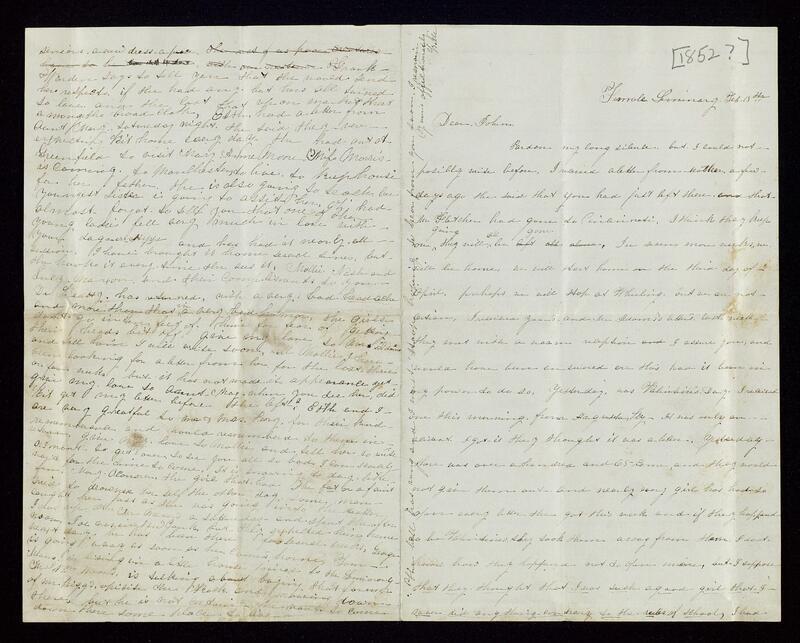 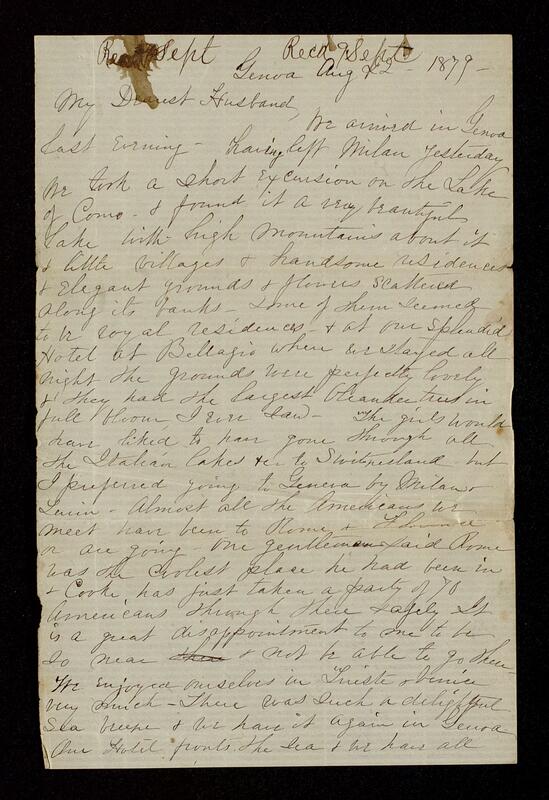 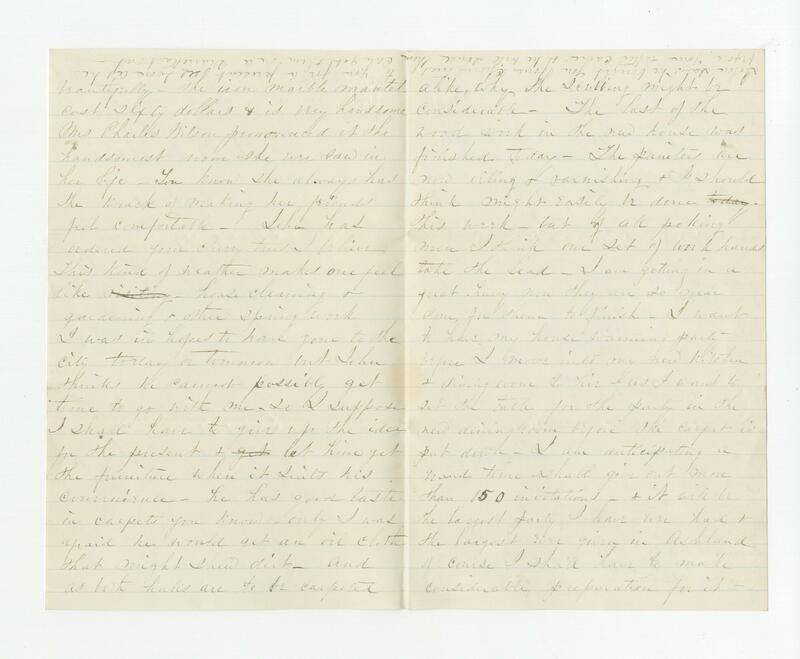 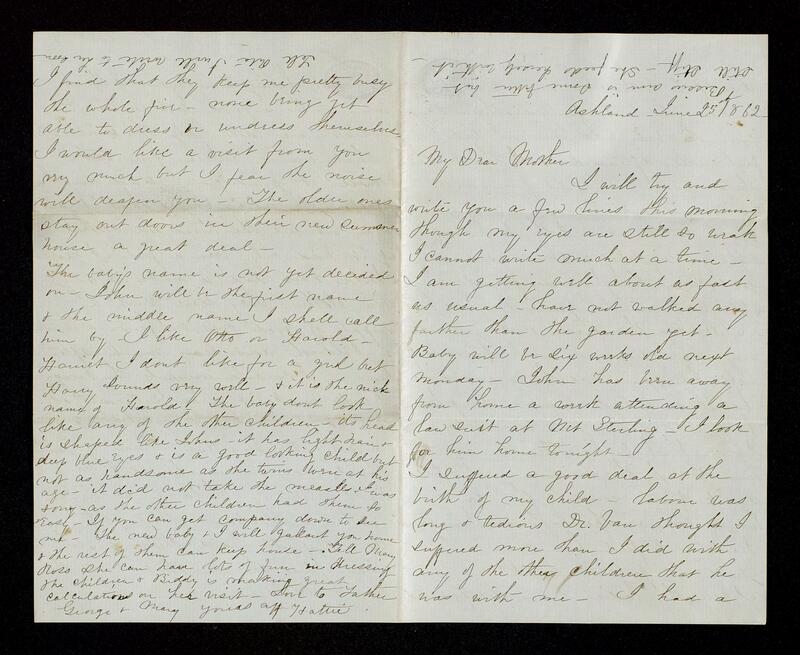 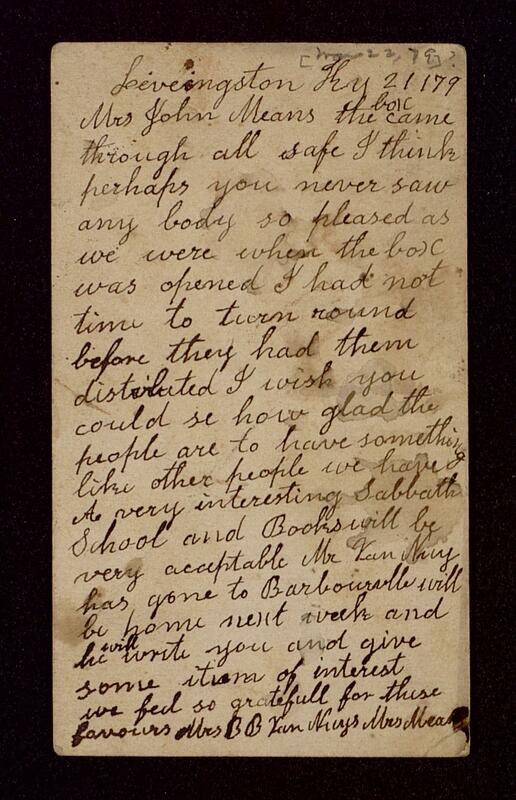 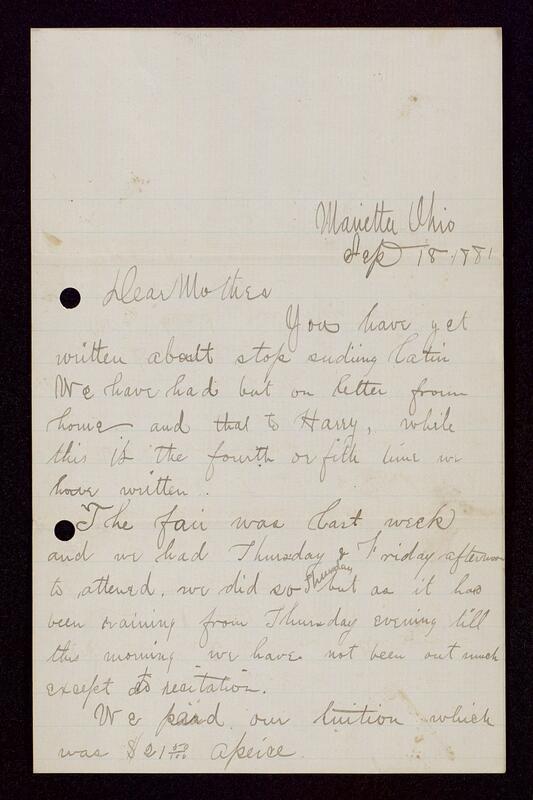 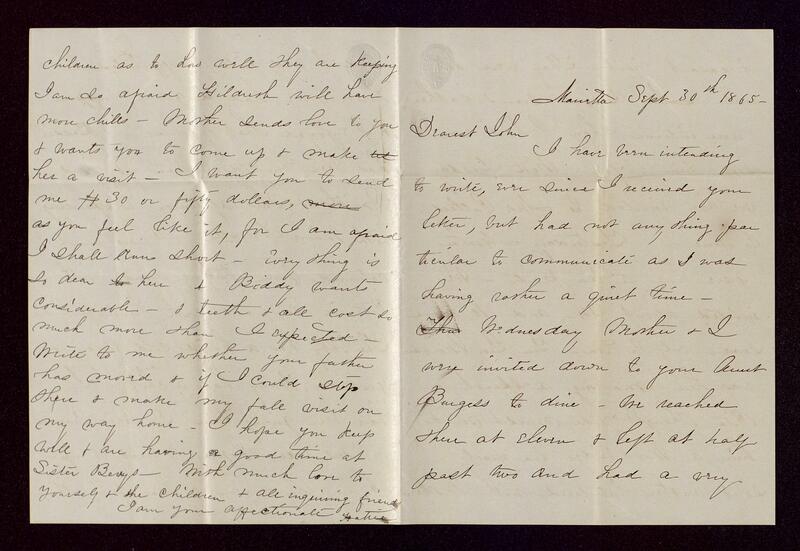 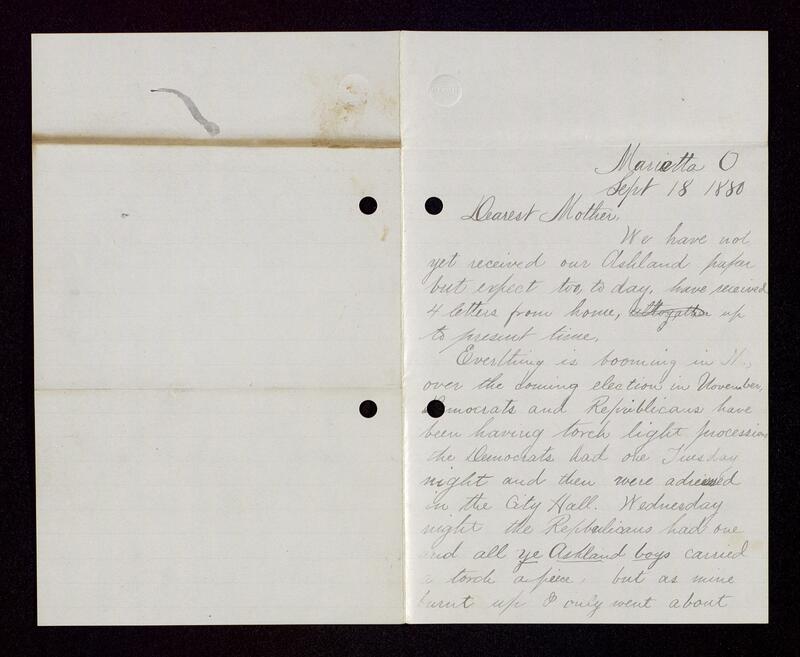 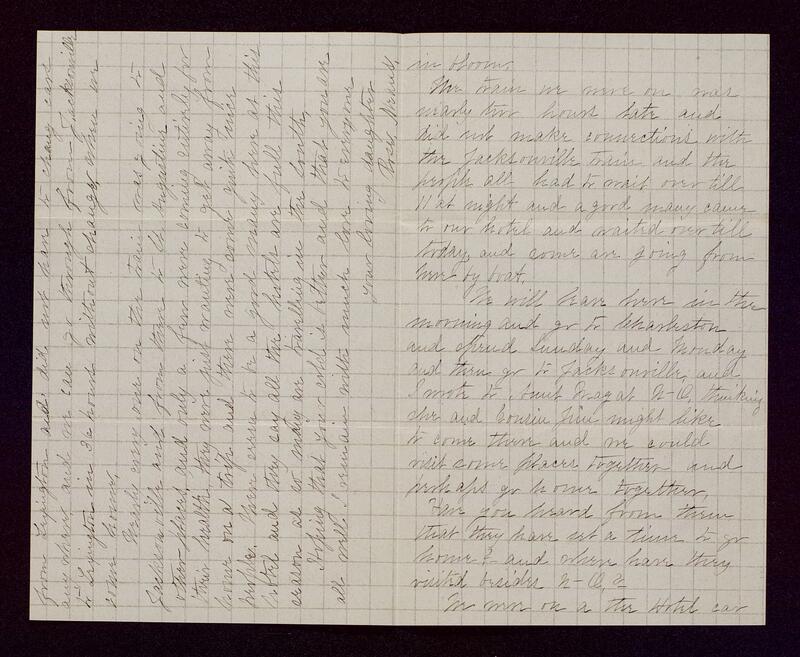 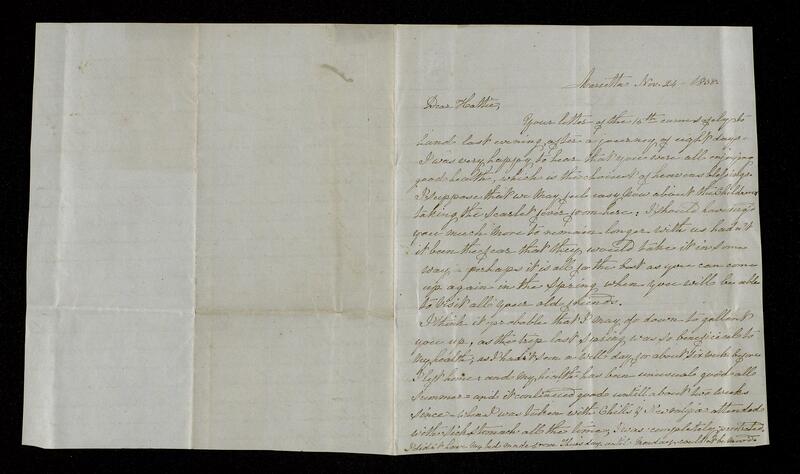 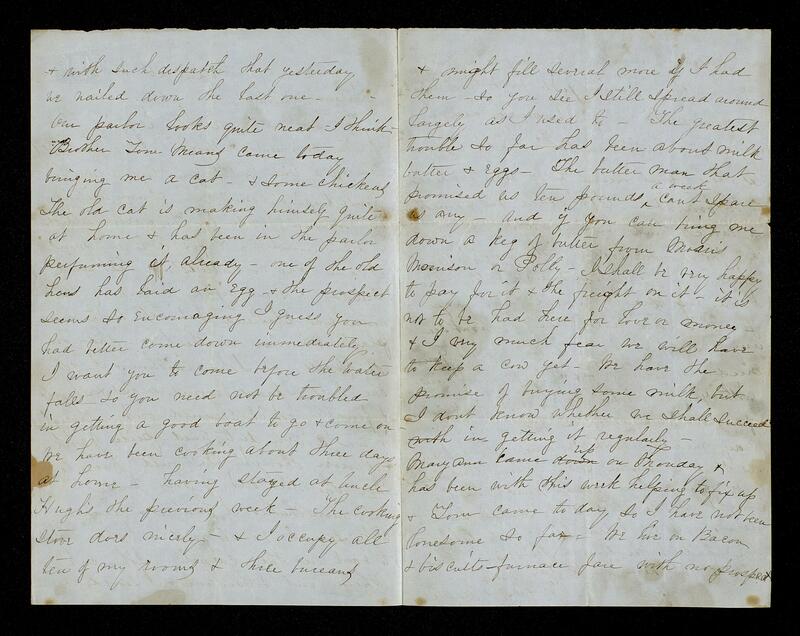 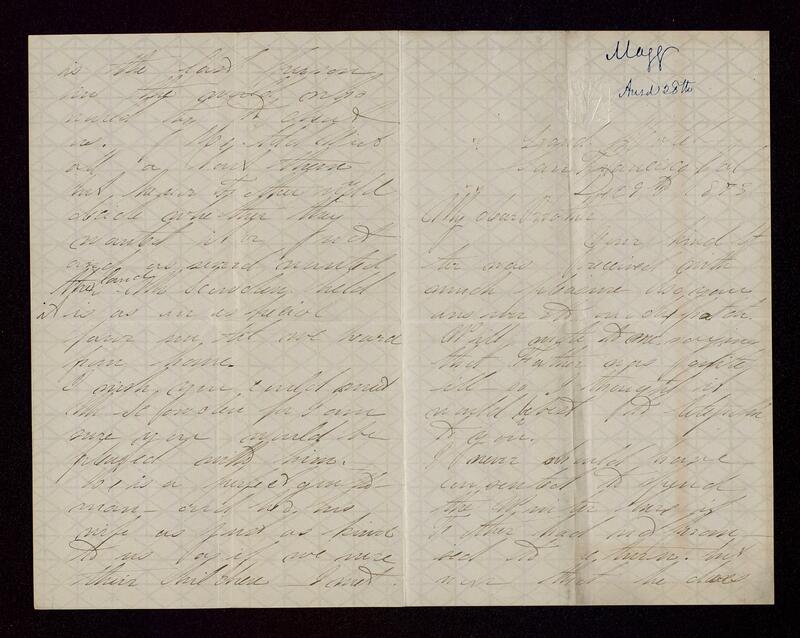 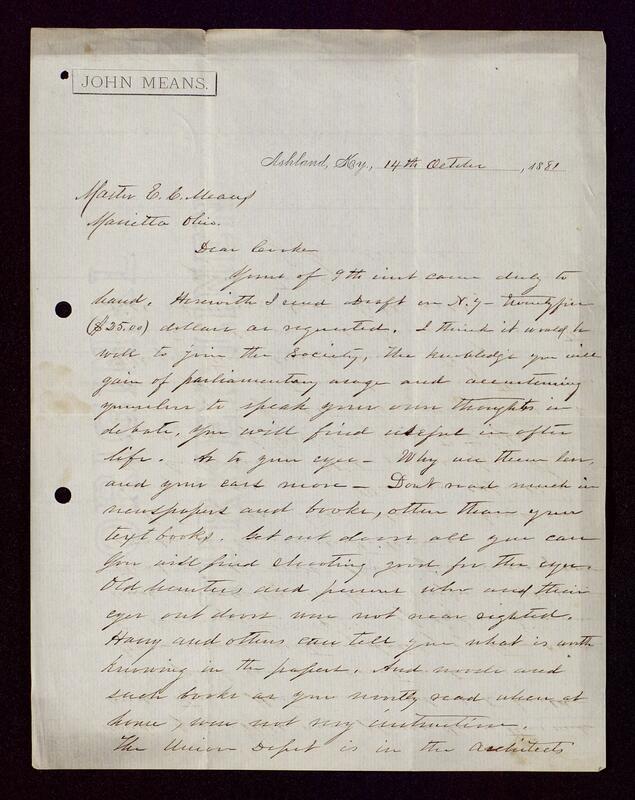 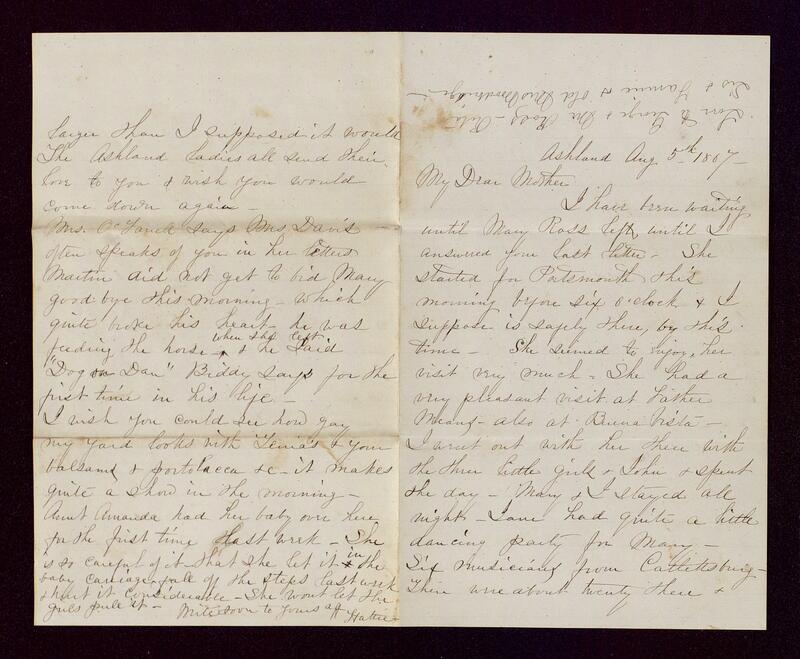 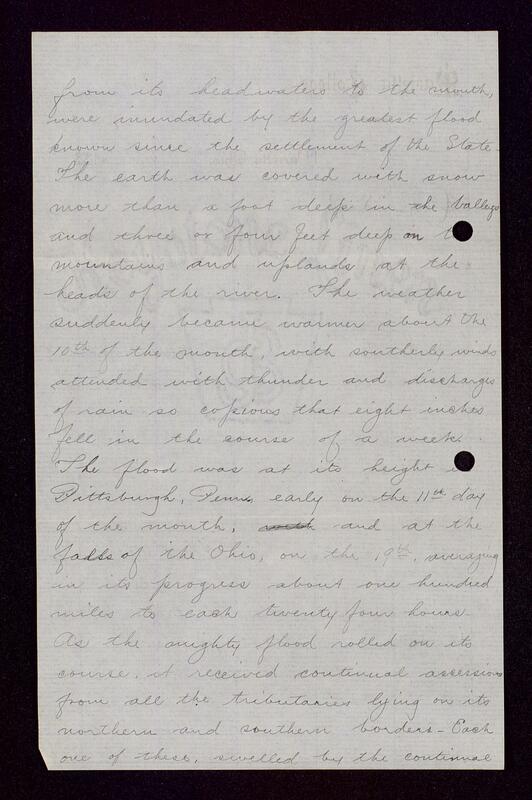 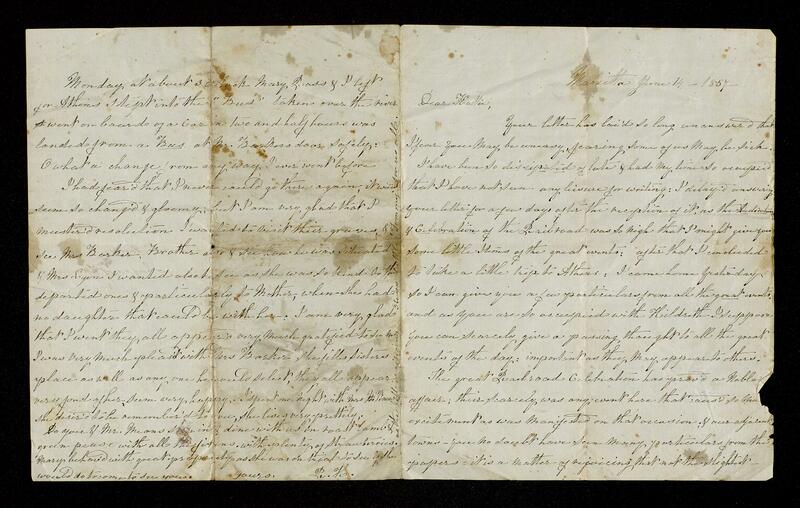 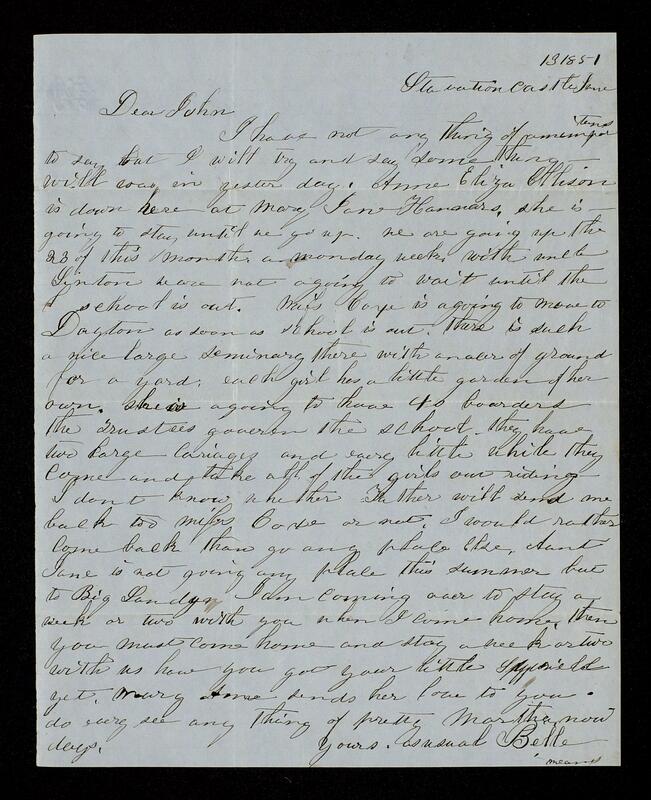 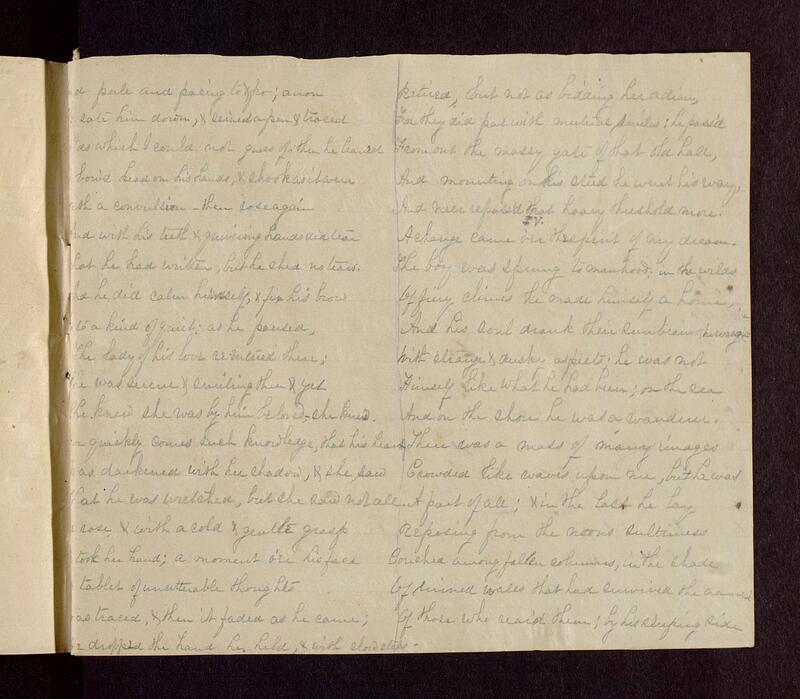 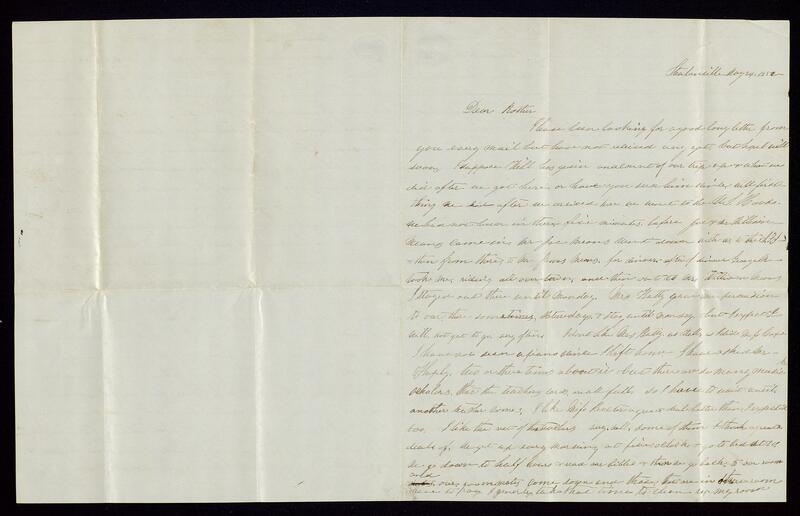 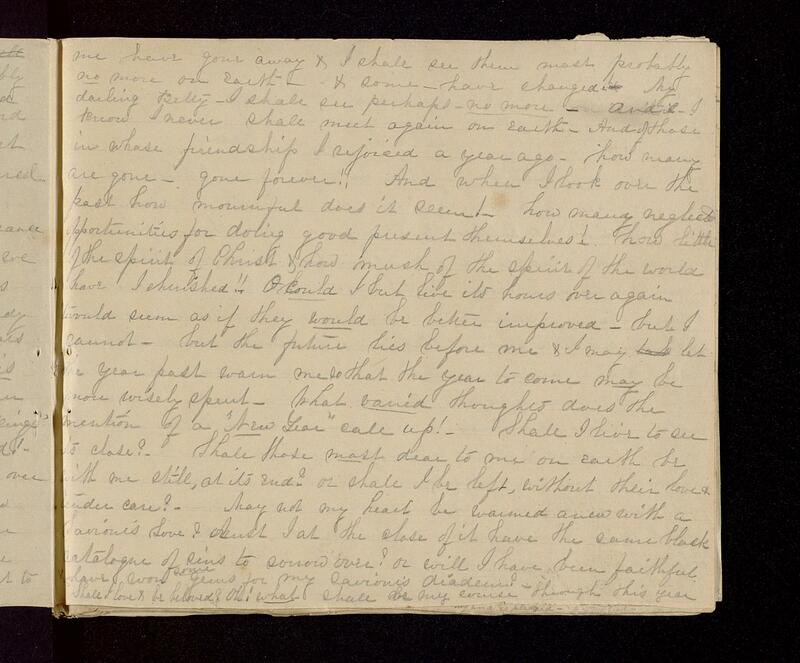 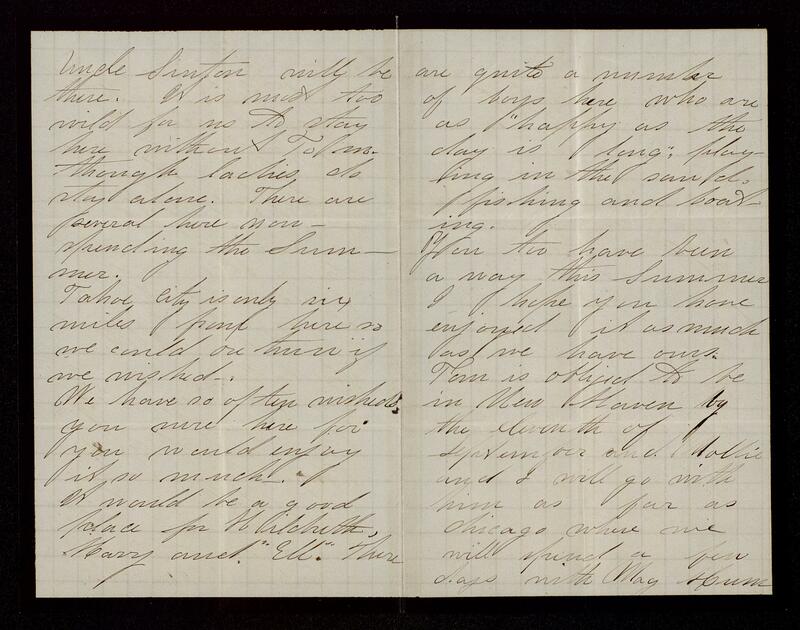 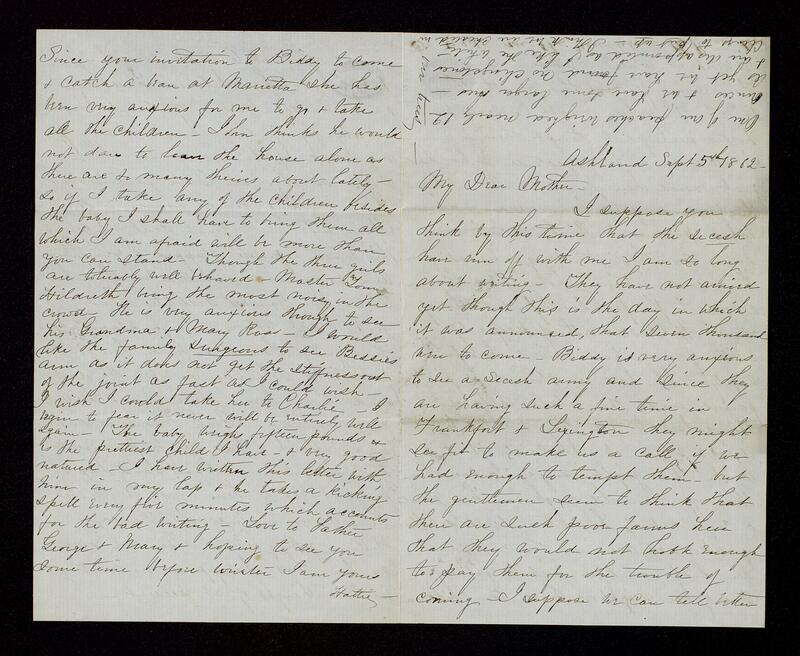 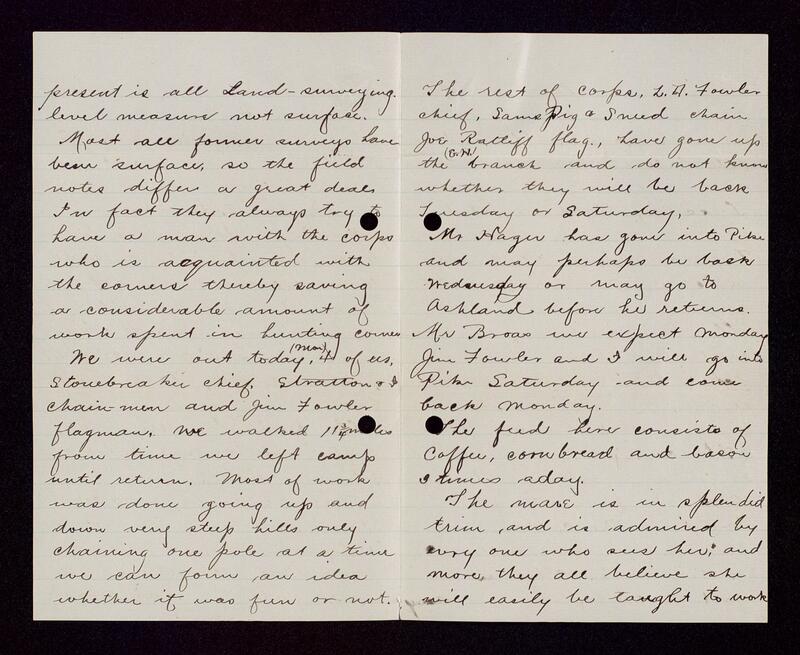 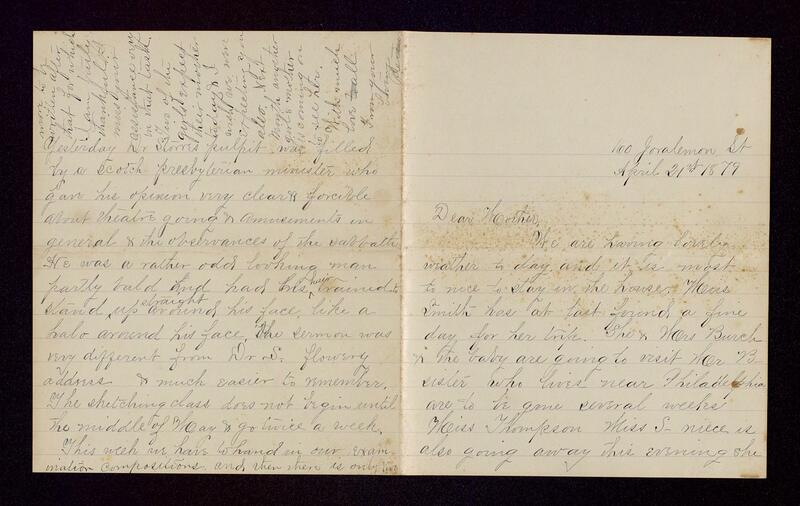 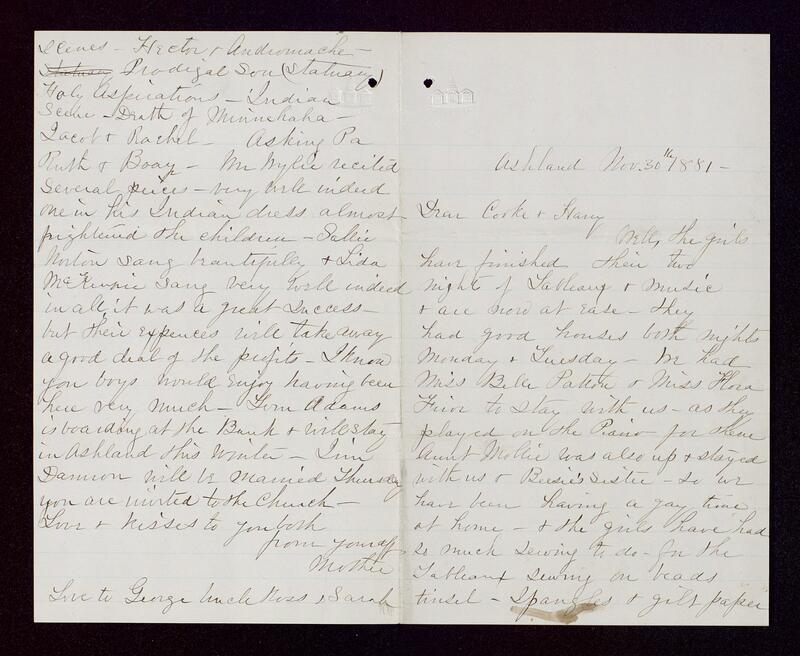 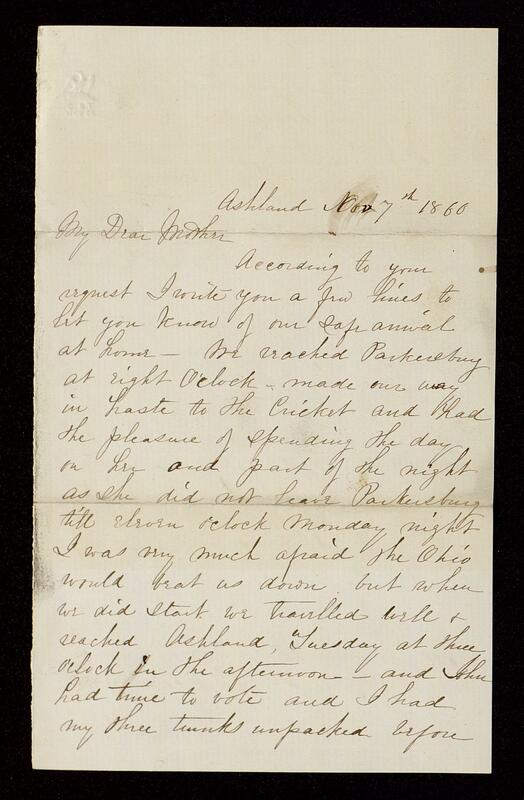 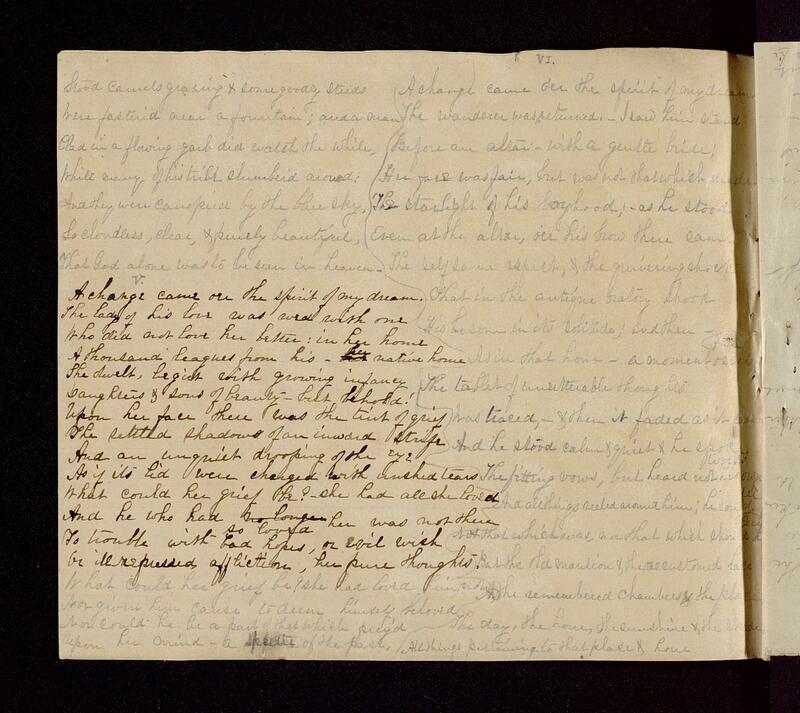 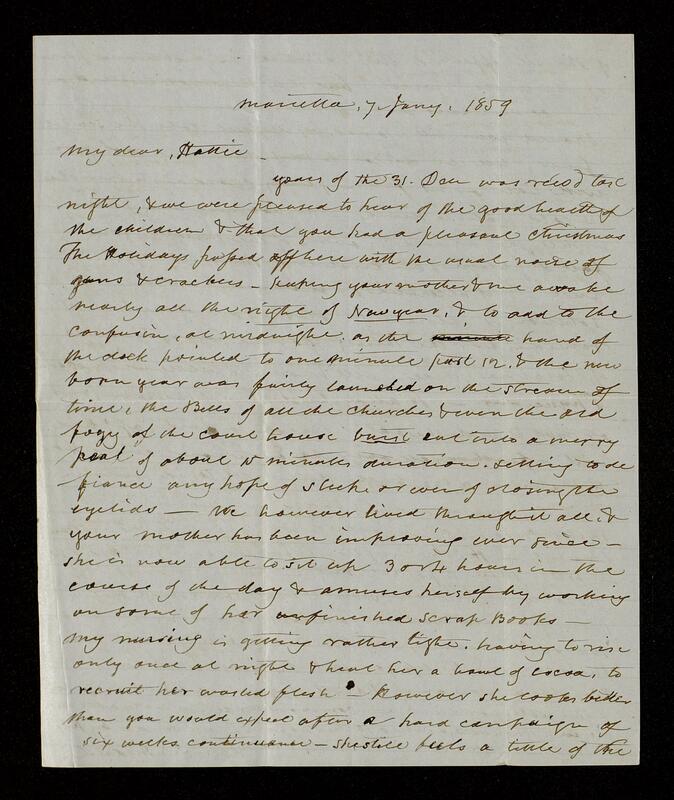 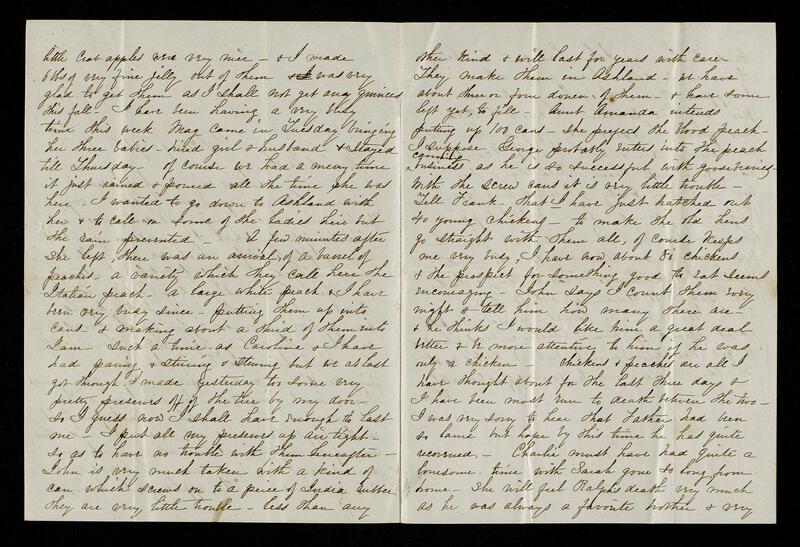 Correspondence between Harriet Means and her mother mentions local attitudes toward the war and news of war-related events occurring near Ashland, KY and Marietta, OH. 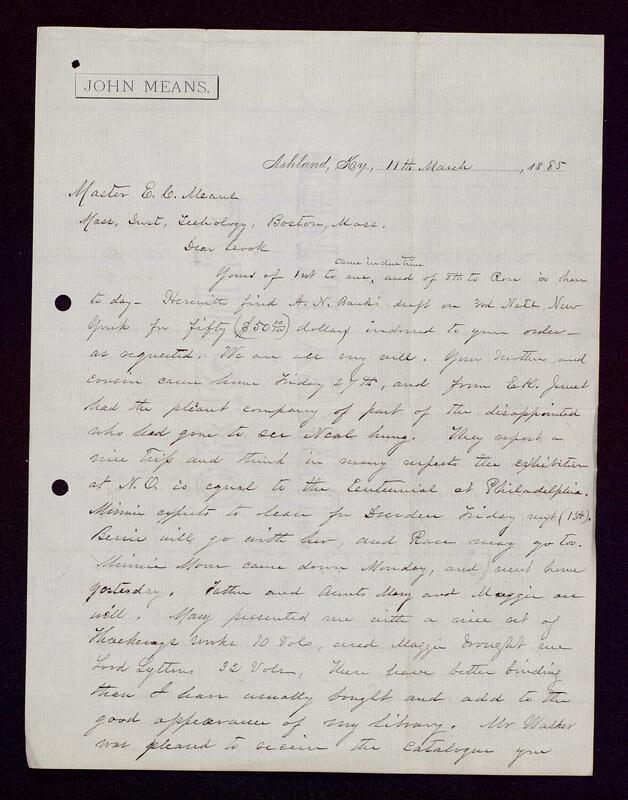 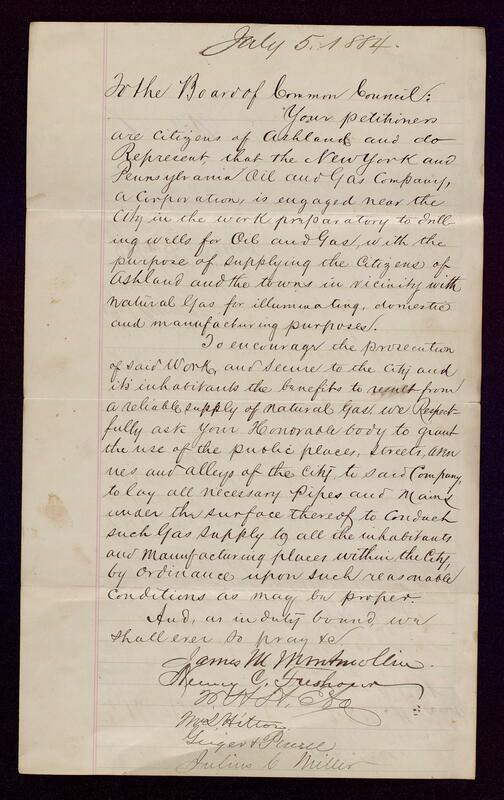 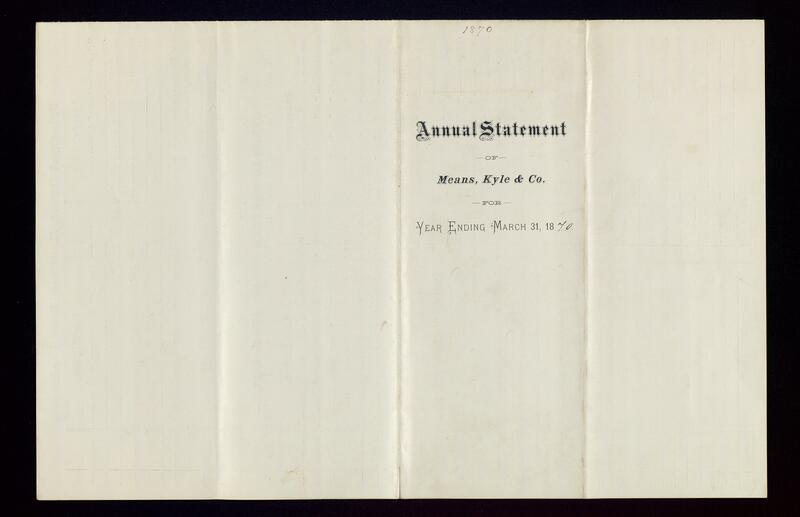 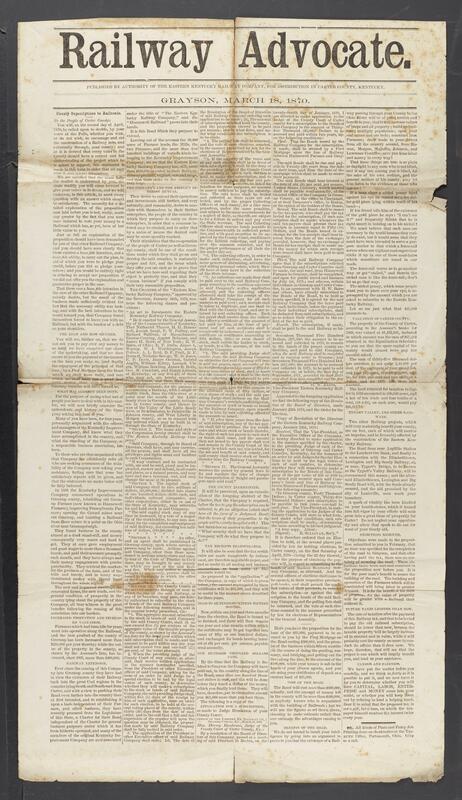 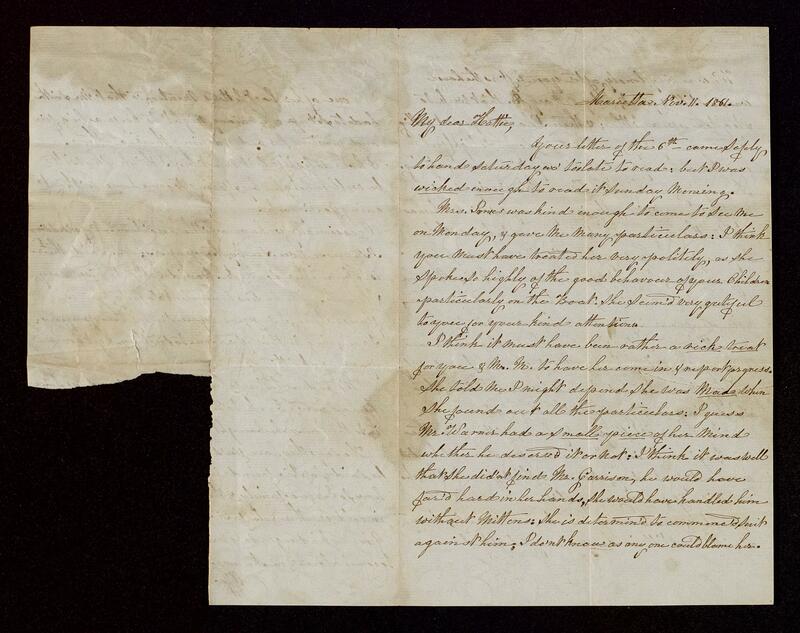 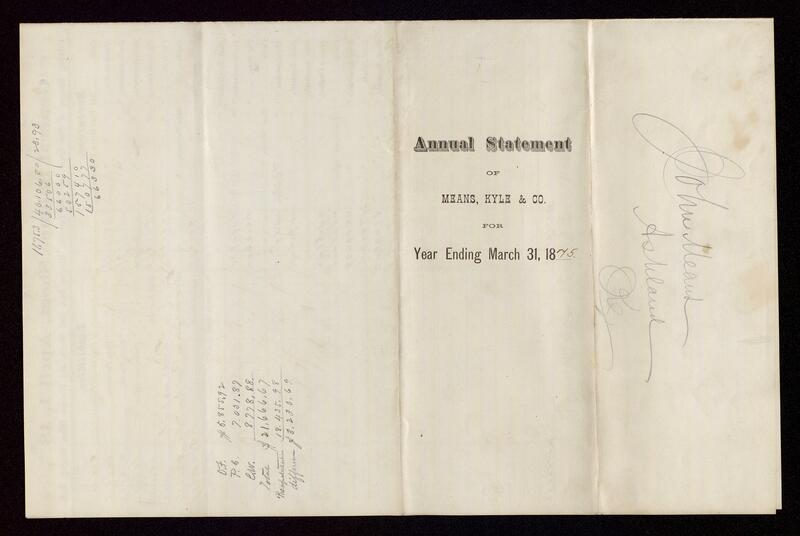 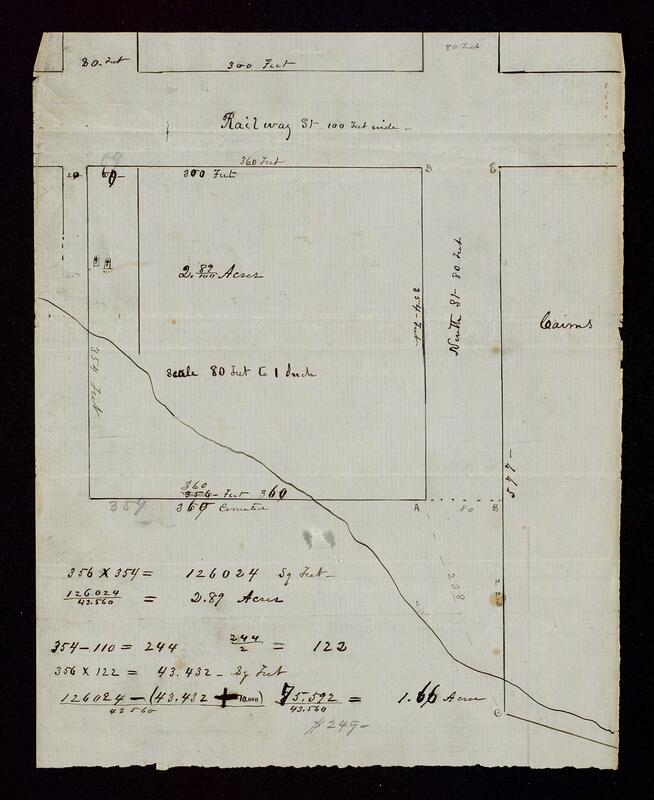 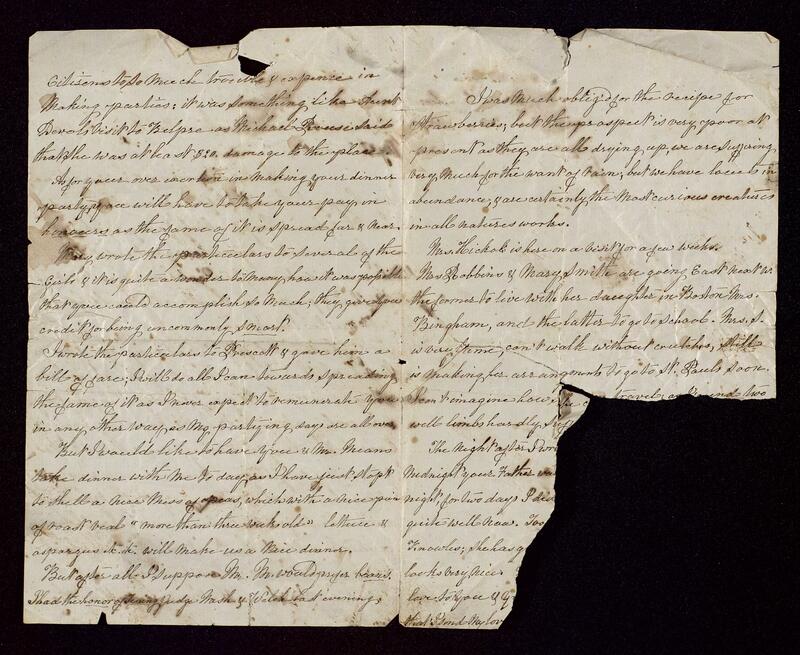 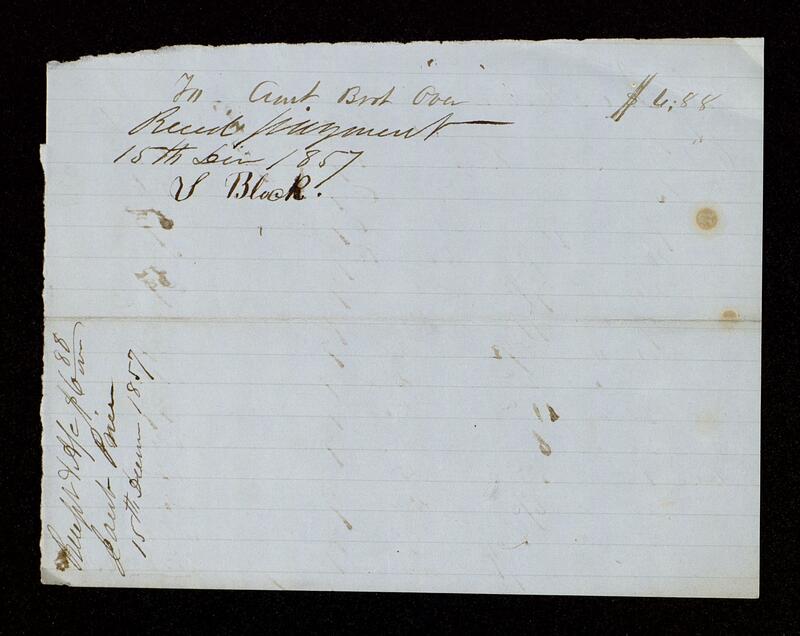 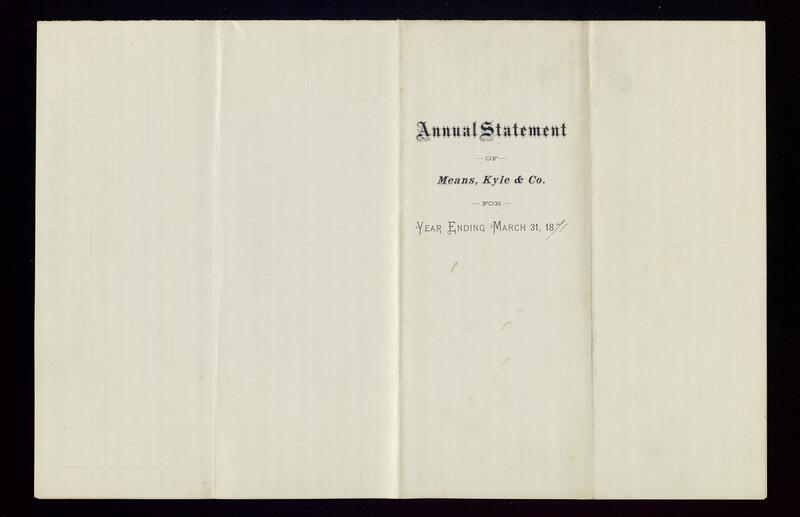 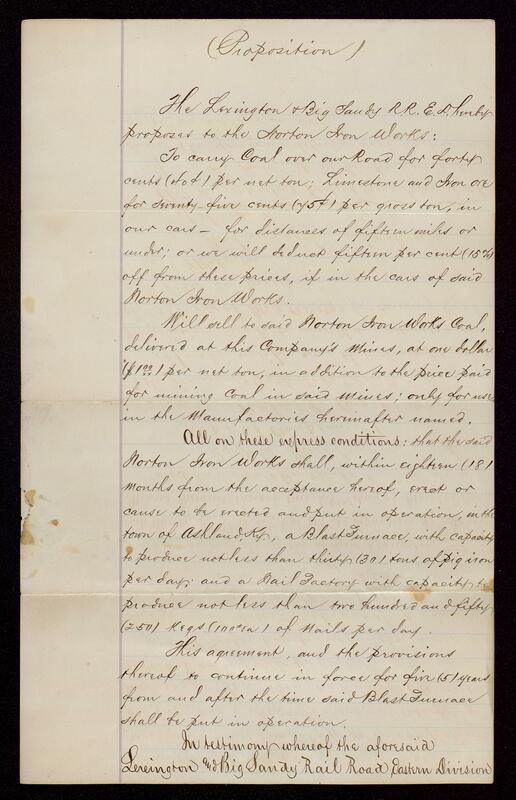 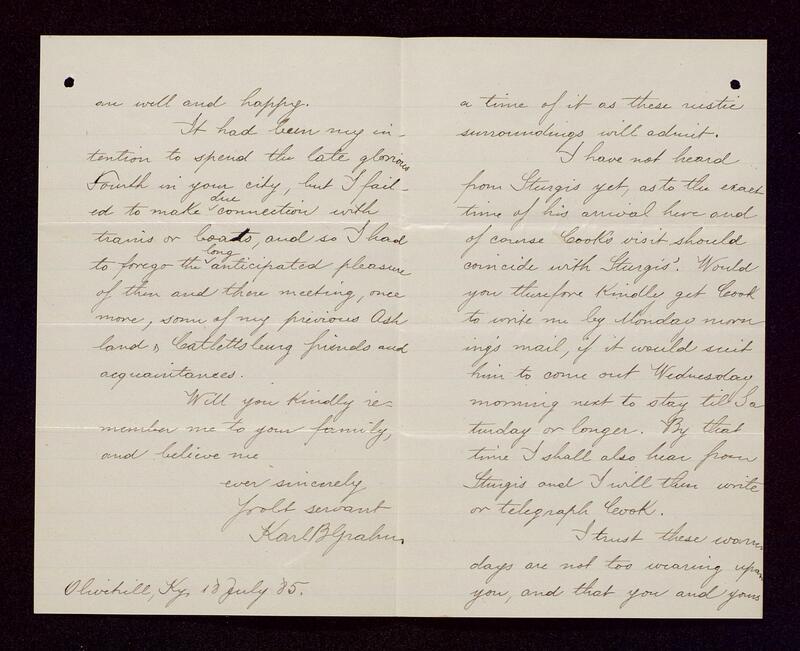 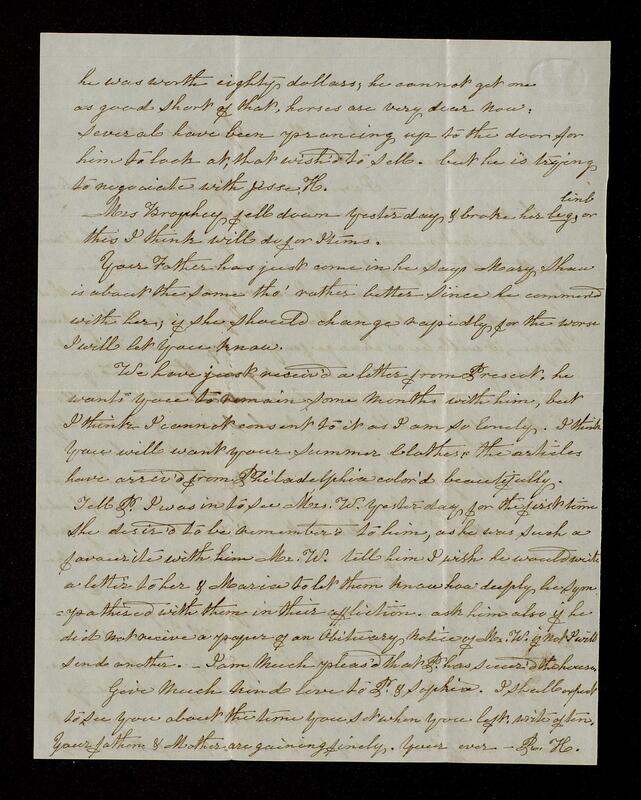 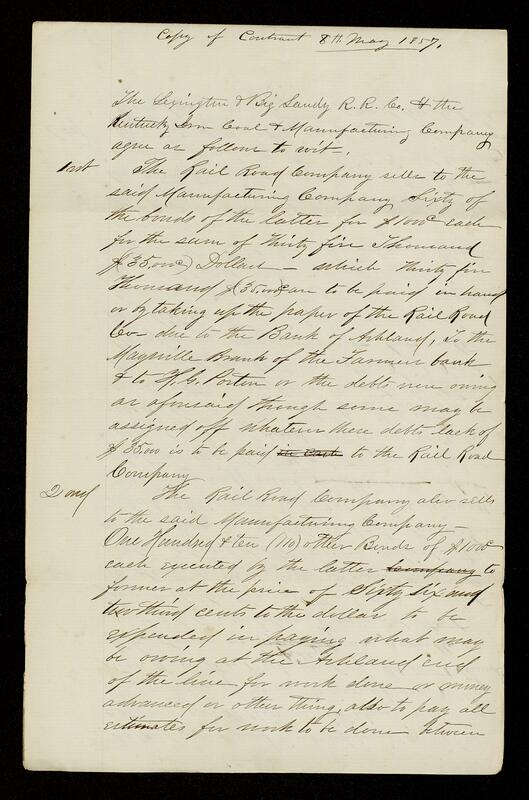 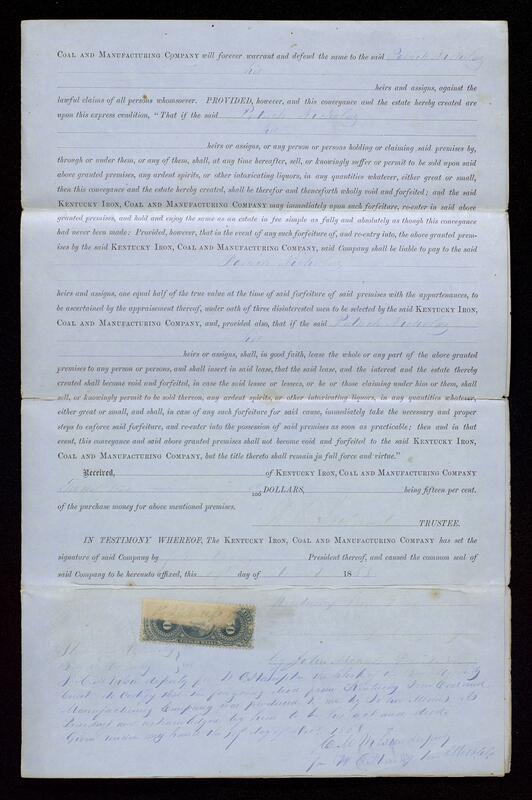 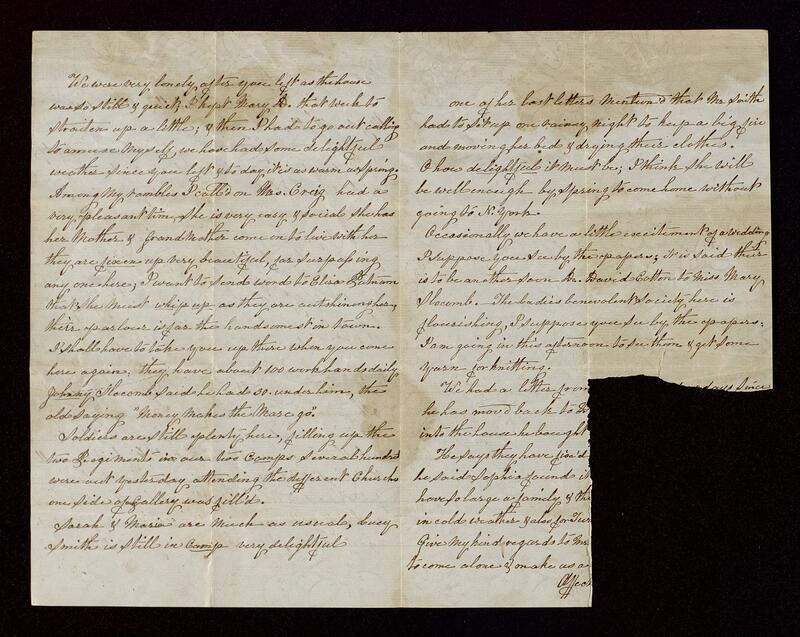 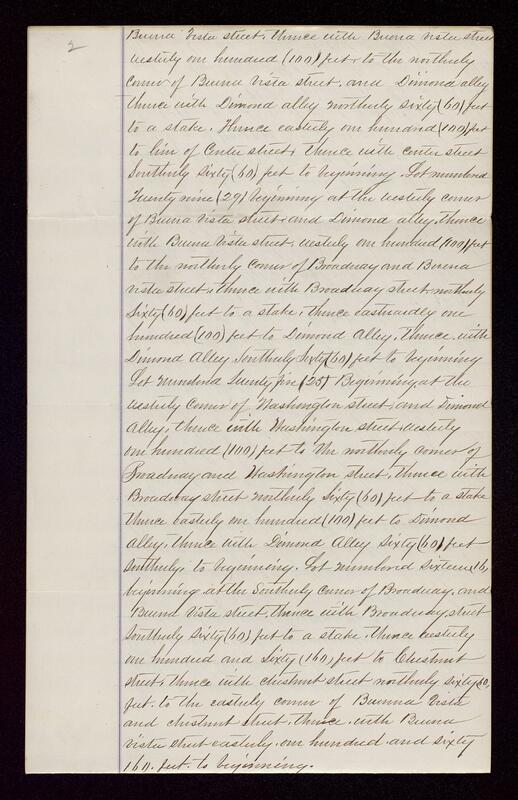 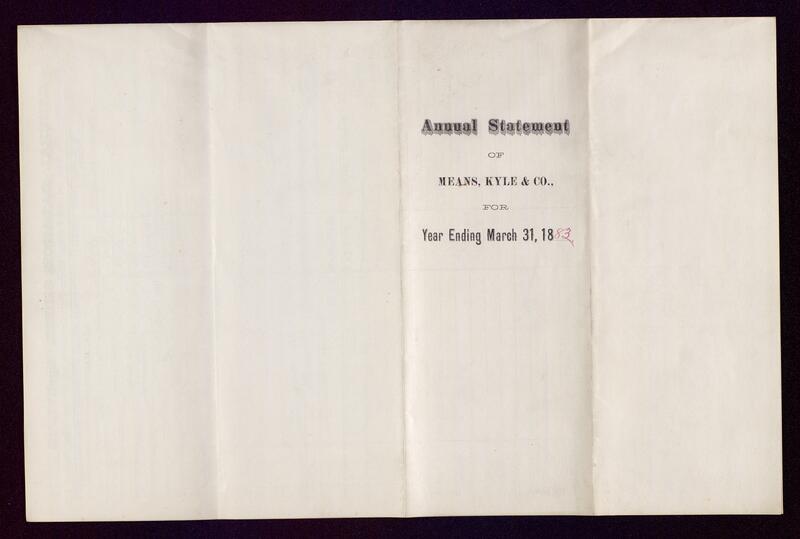 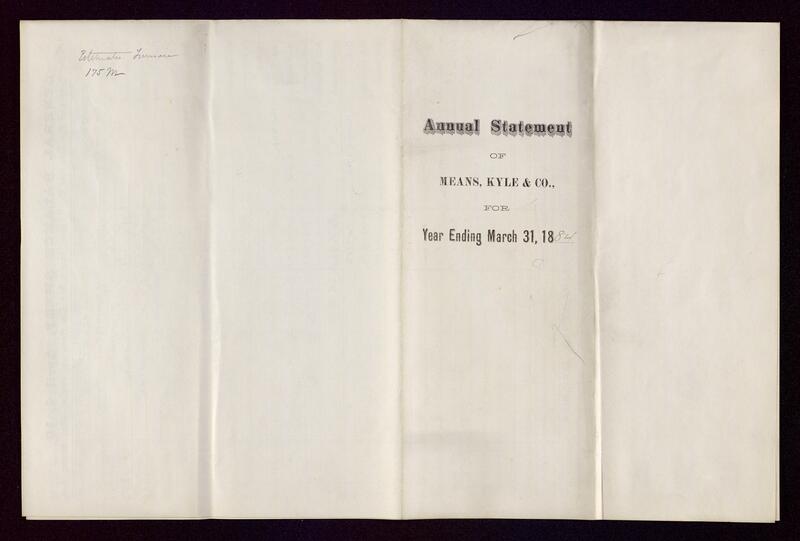 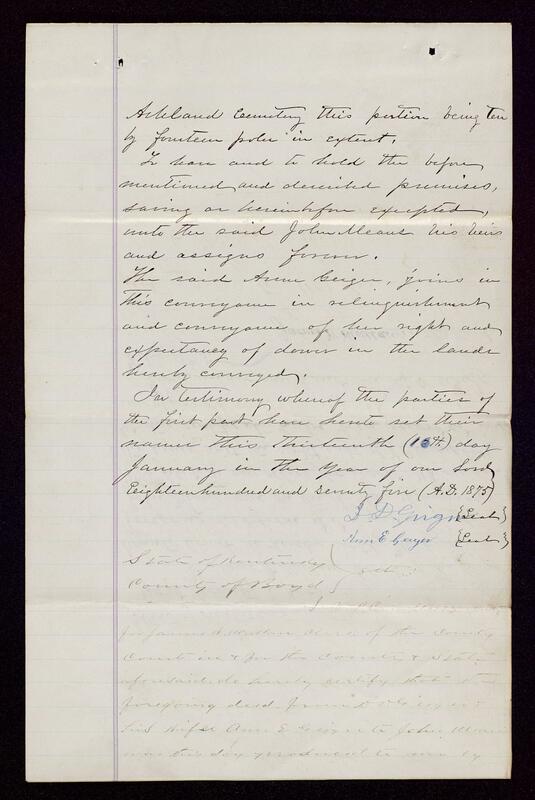 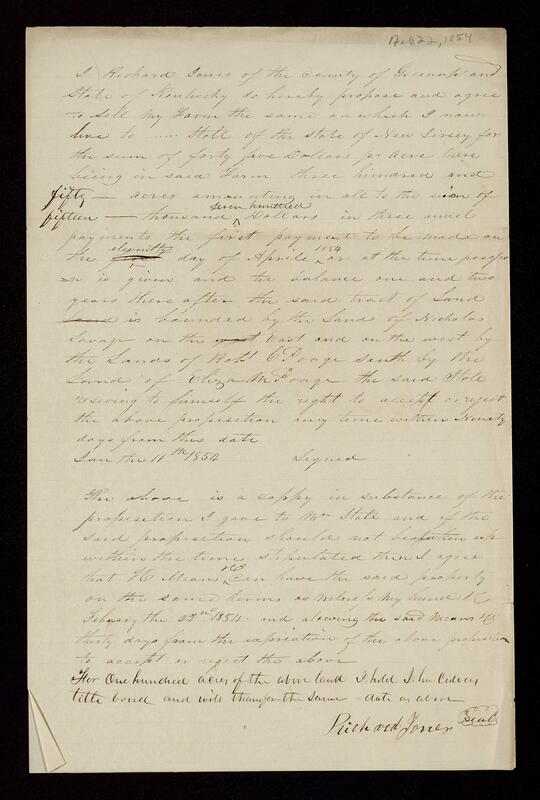 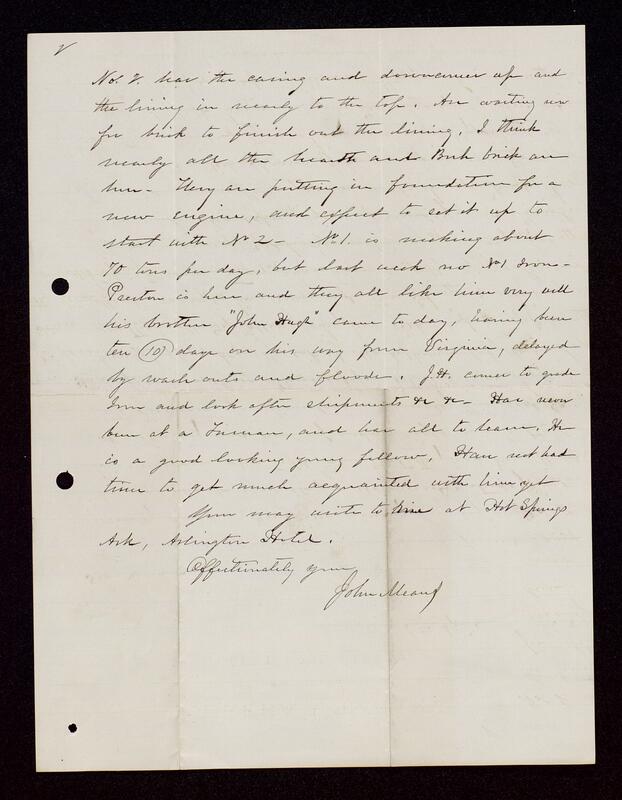 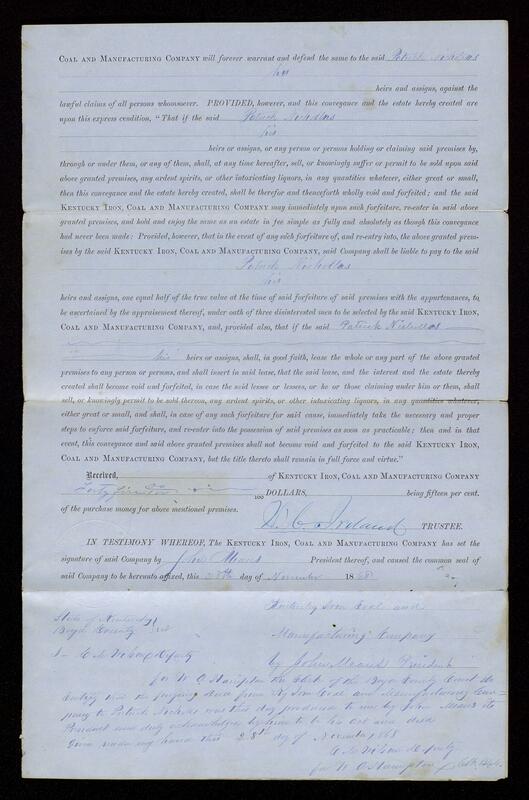 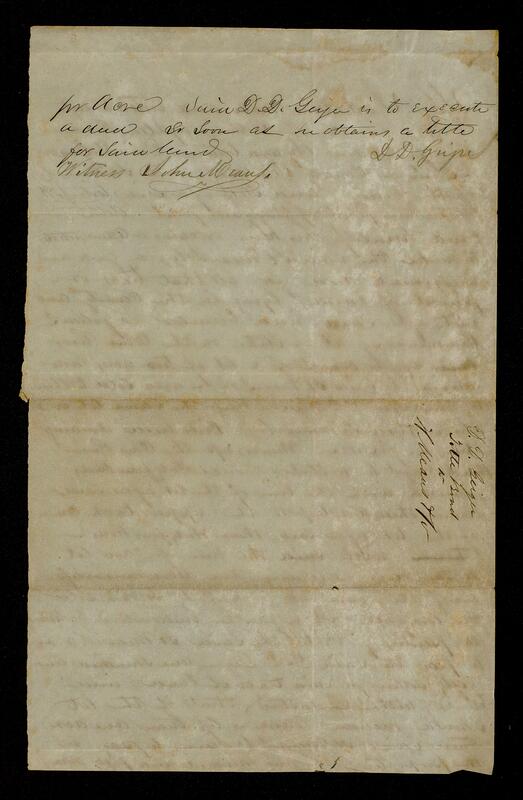 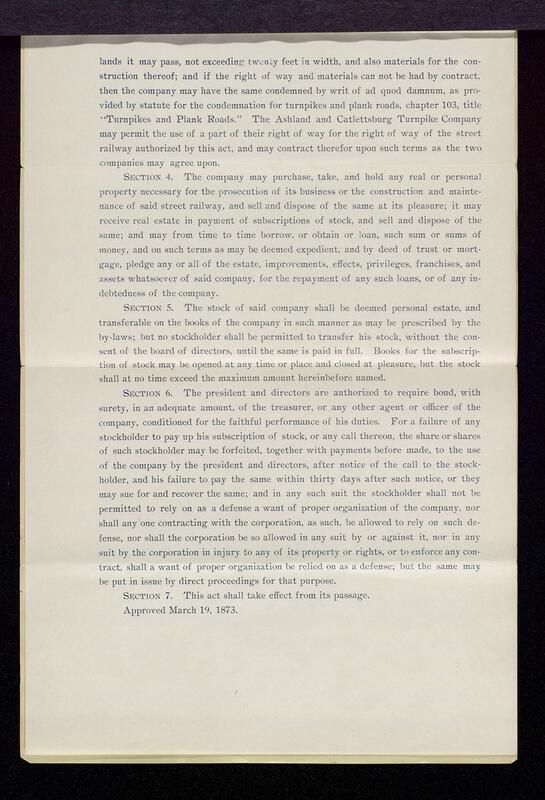 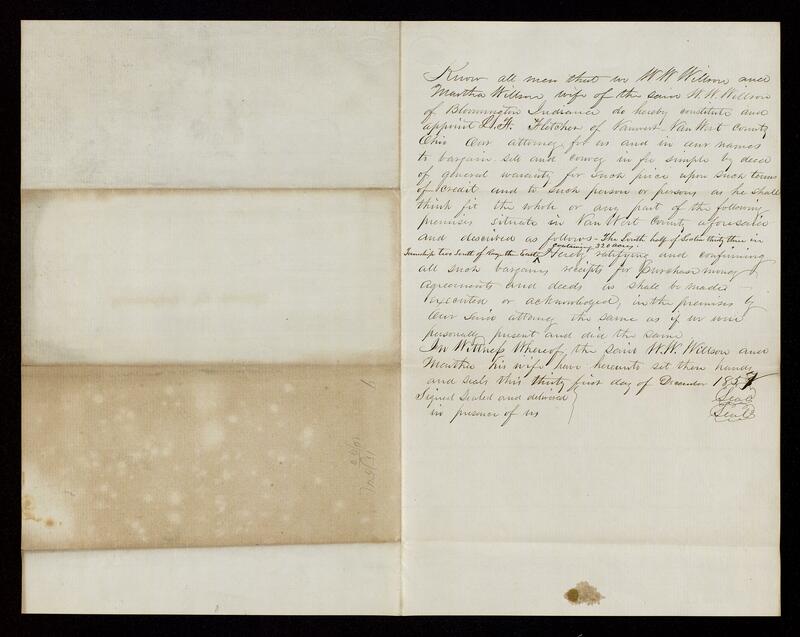 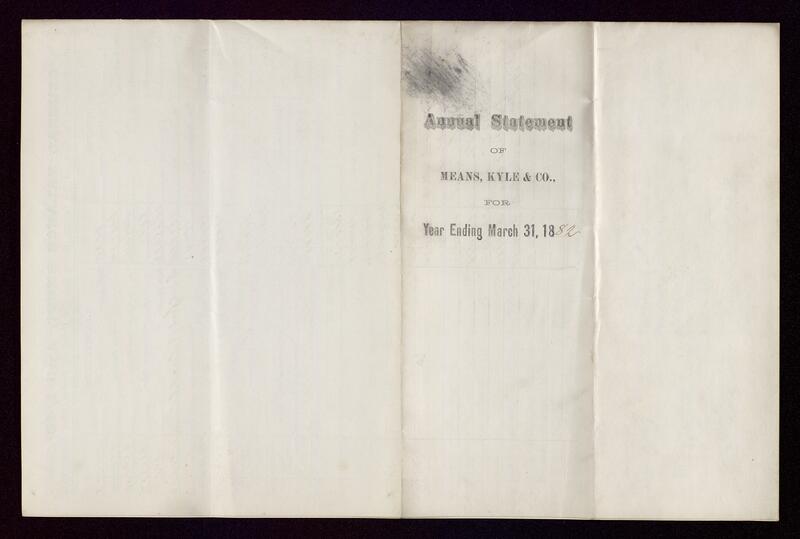 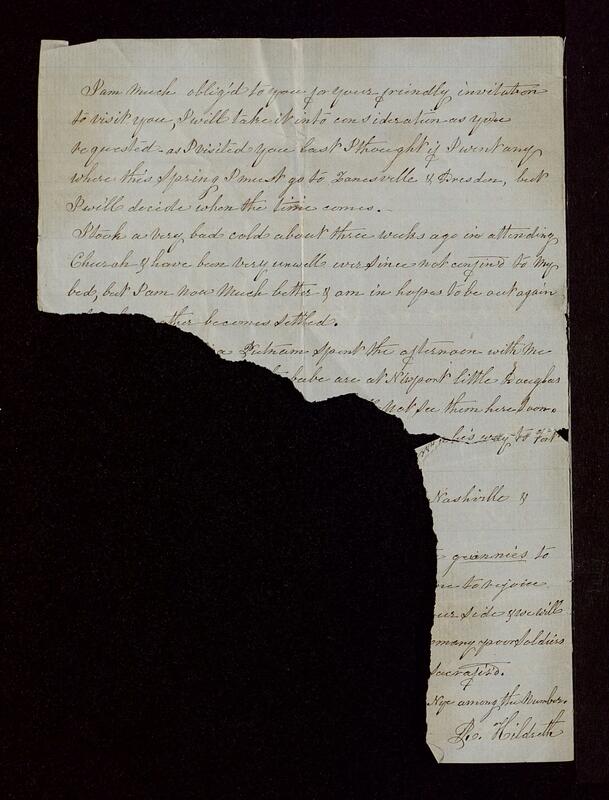 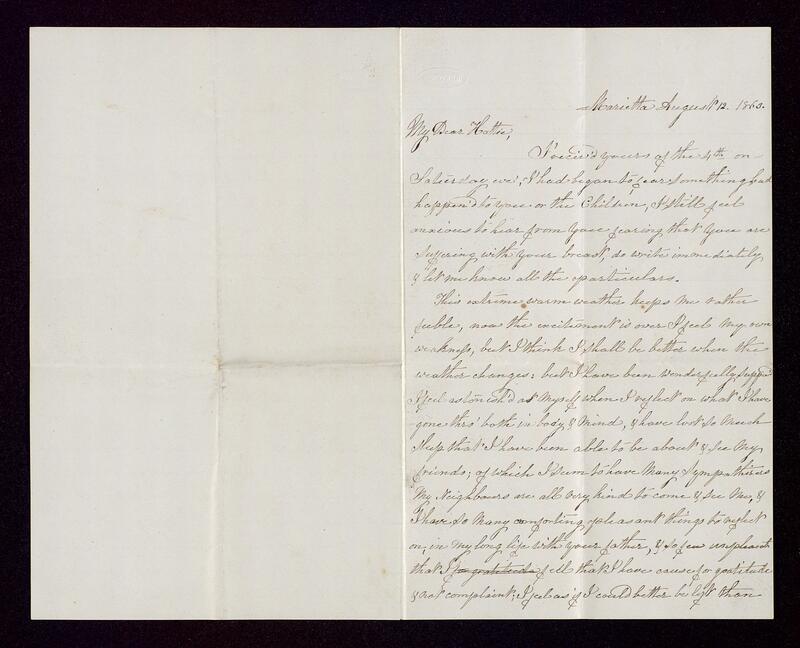 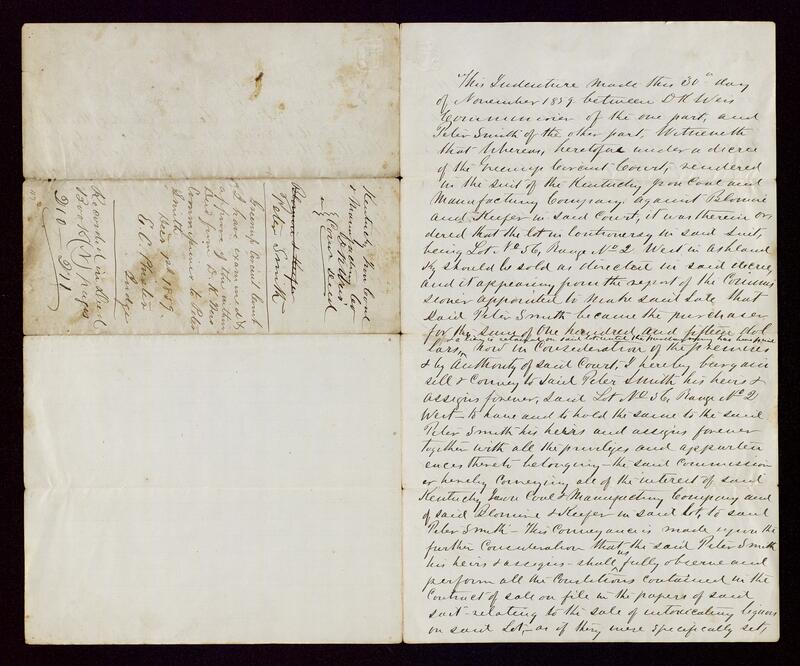 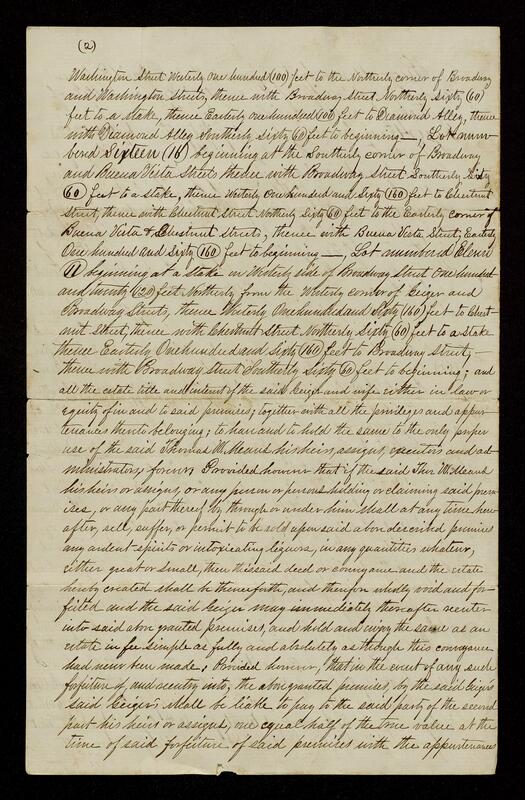 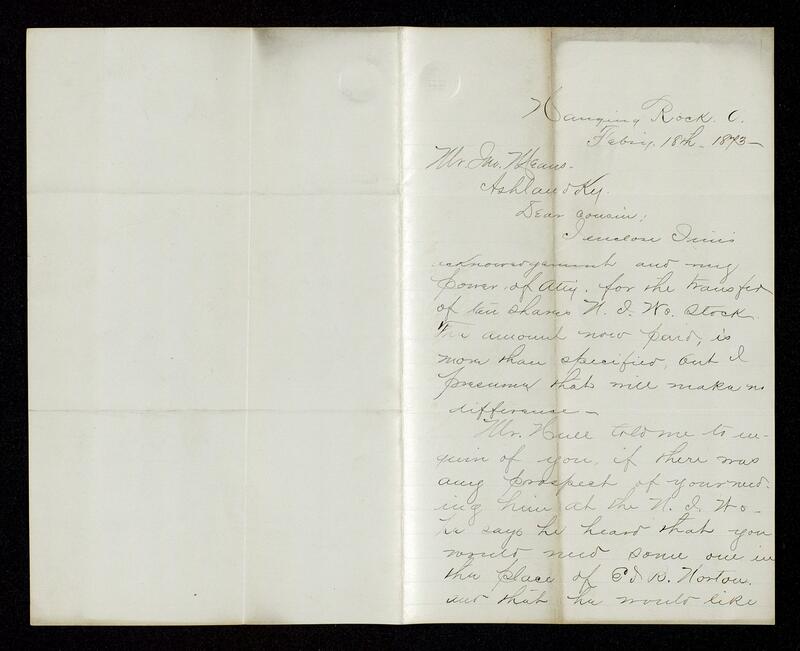 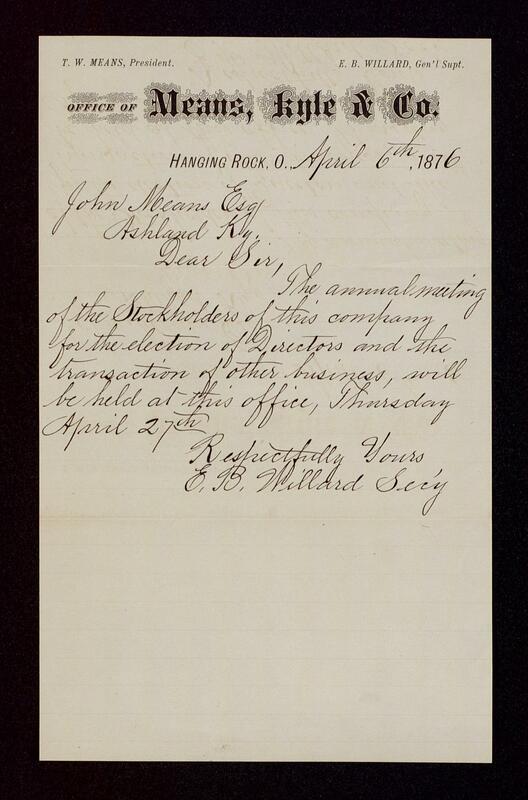 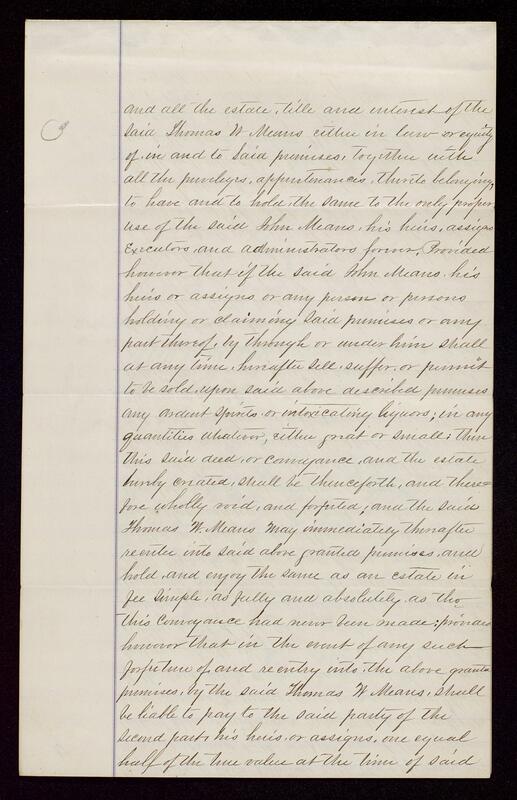 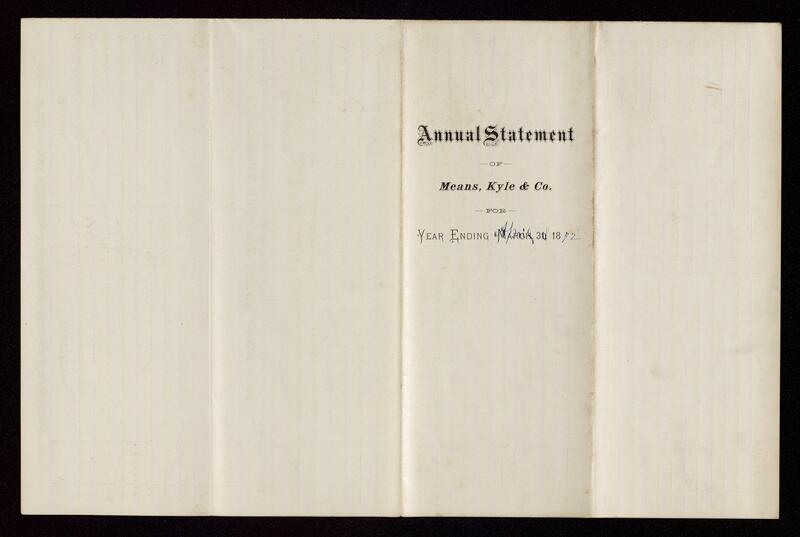 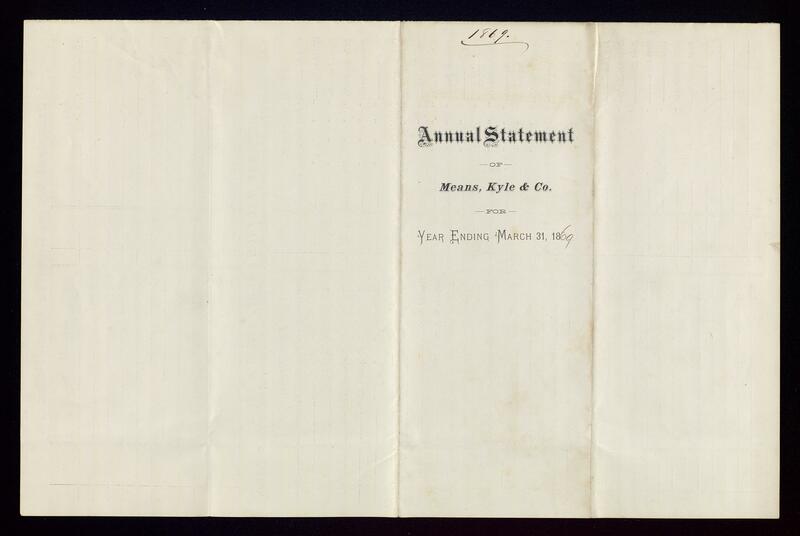 Along with a few miscellaneous personal letters, this period mostly consists of financial, legal, and business papers relating to the formation of the Means, Kyle and Company, a Hanging Rock Region Iron and Coal Corporation, of which Thomas W. Means was president. 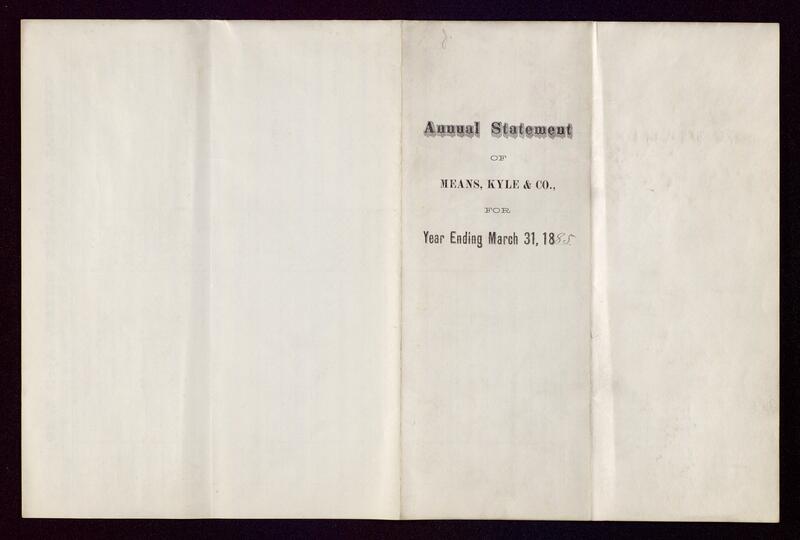 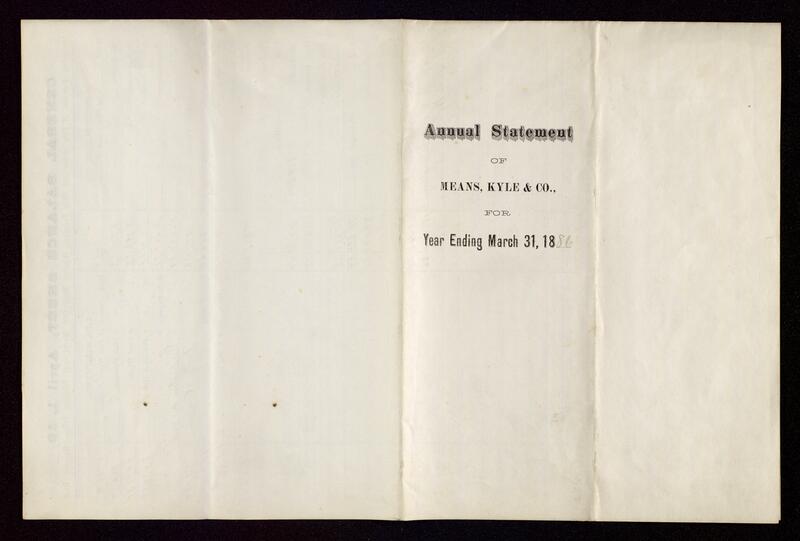 Included here are more business letters and financial statements of the Means, Kyle and Company. 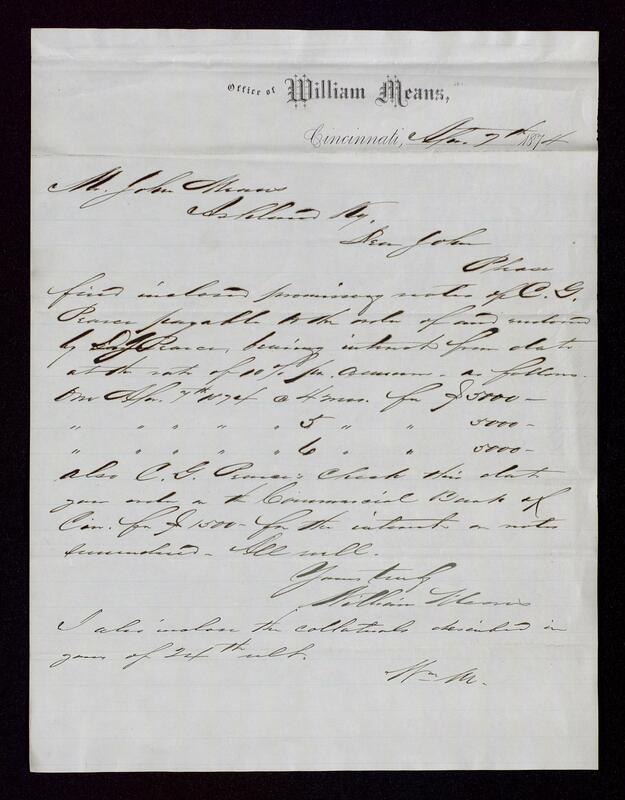 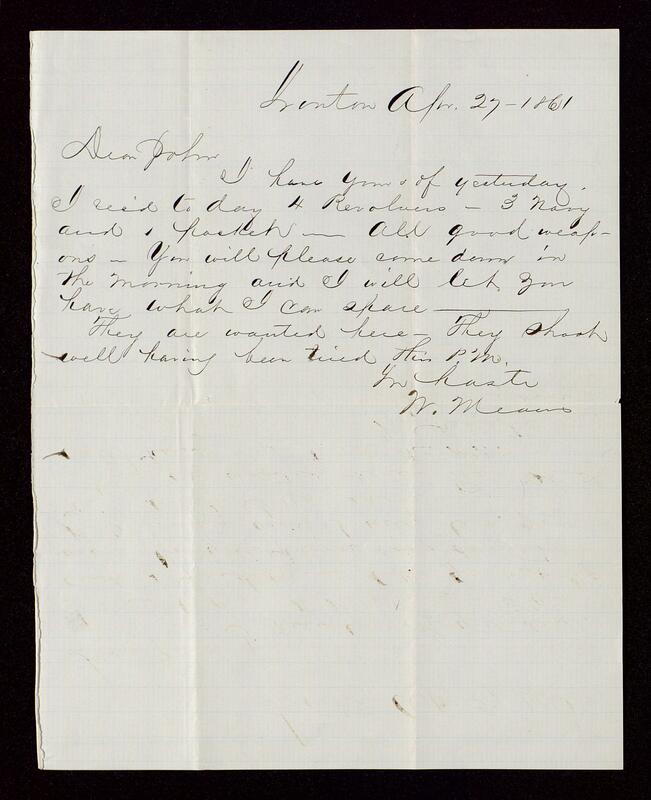 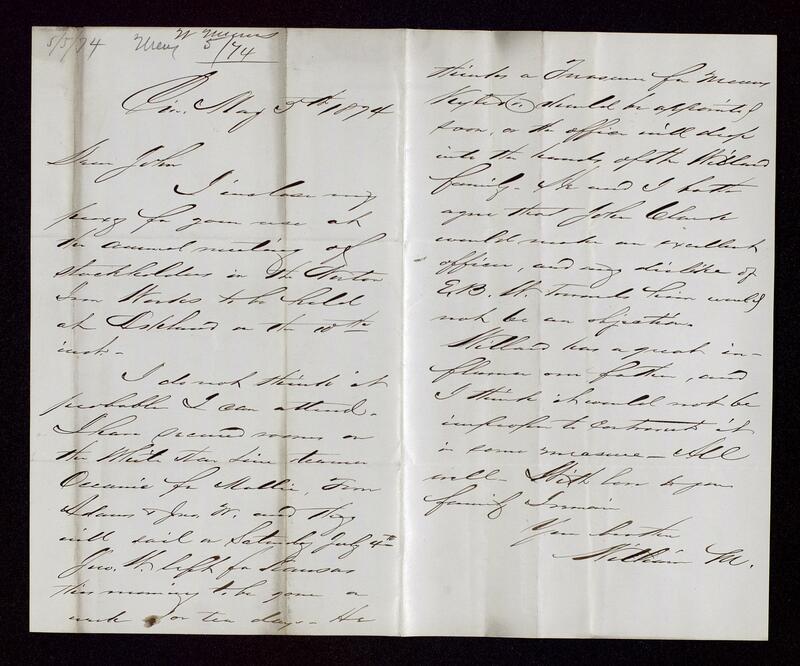 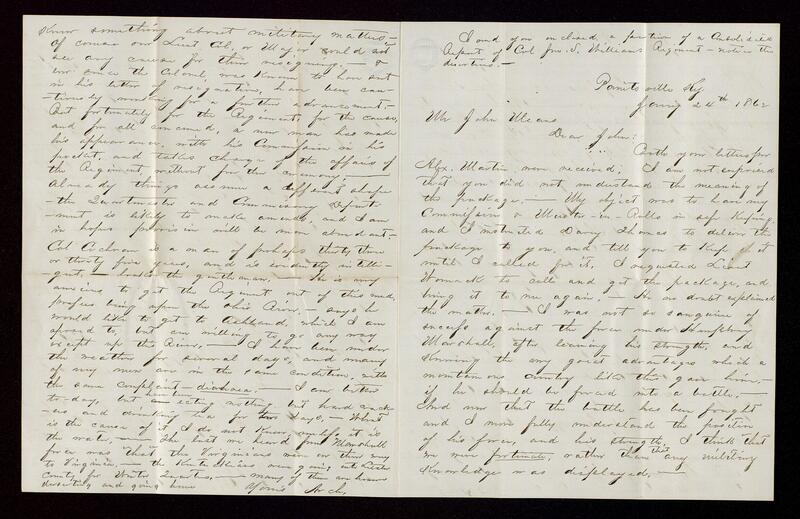 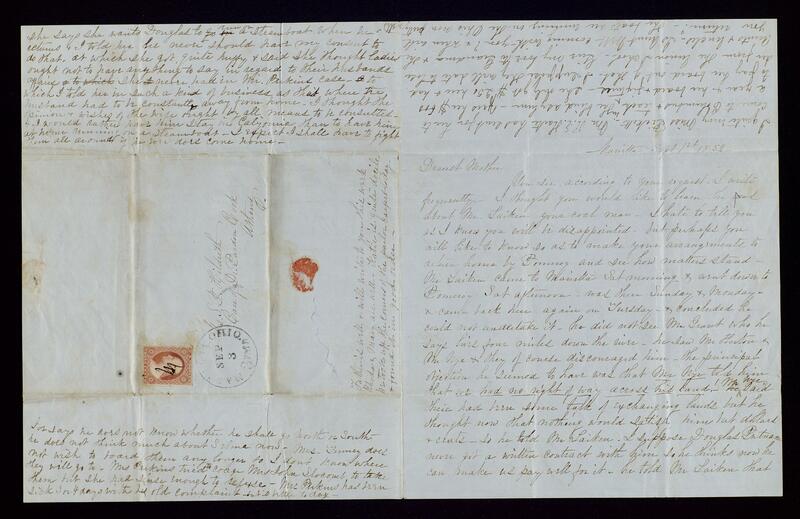 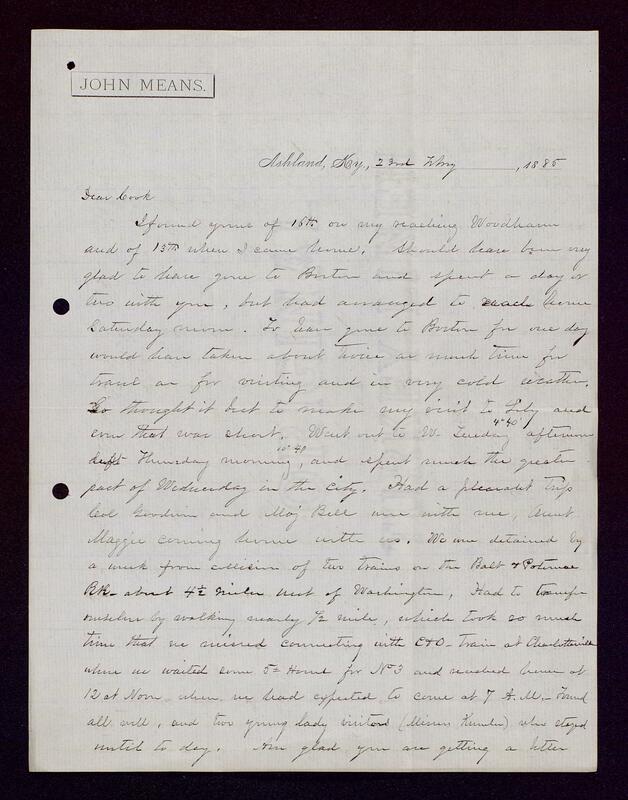 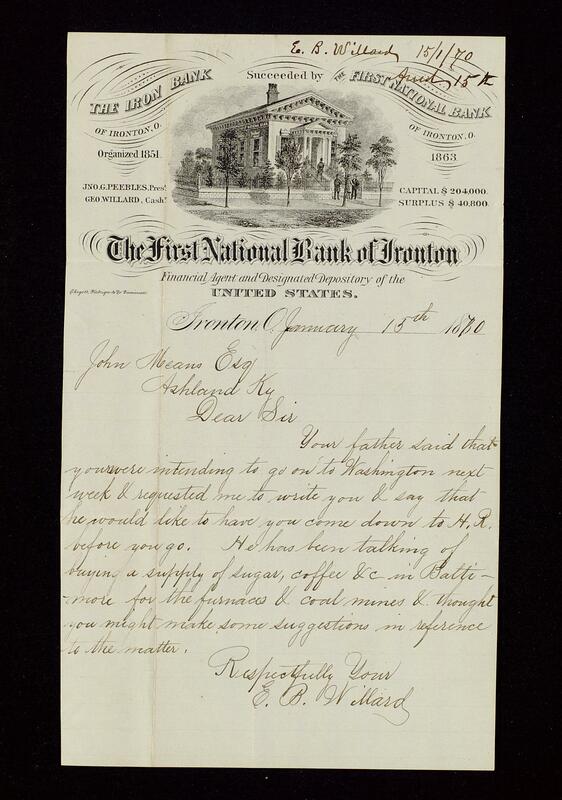 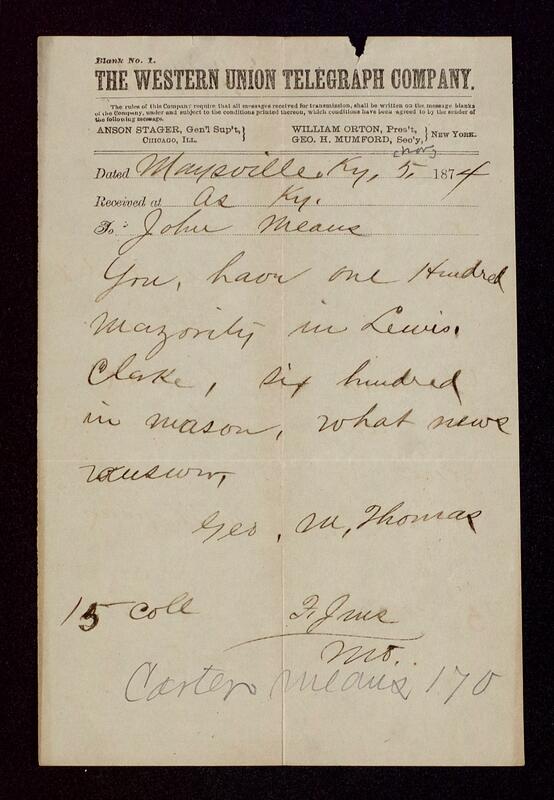 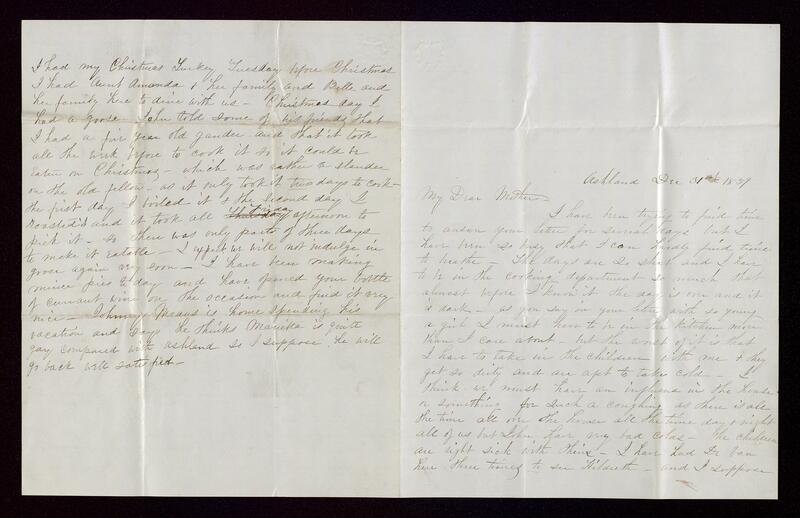 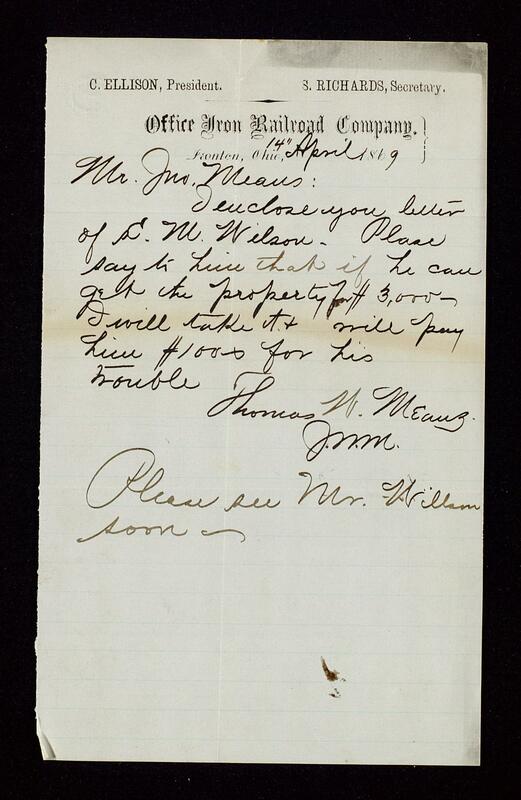 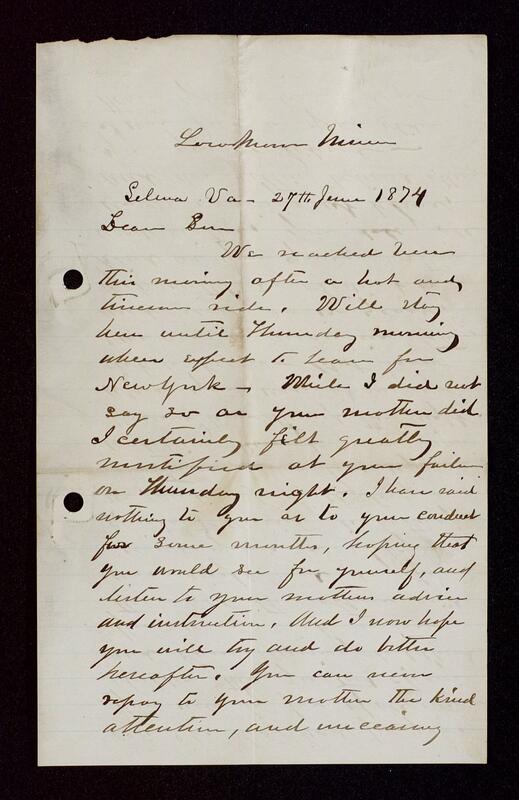 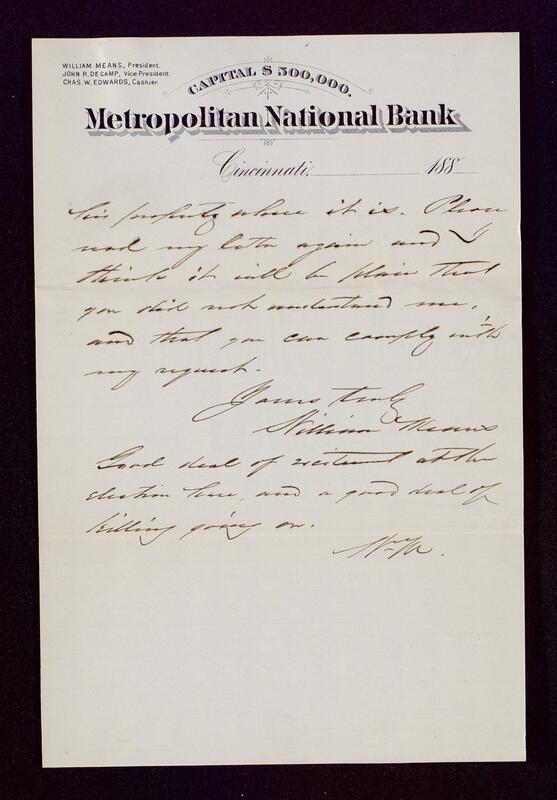 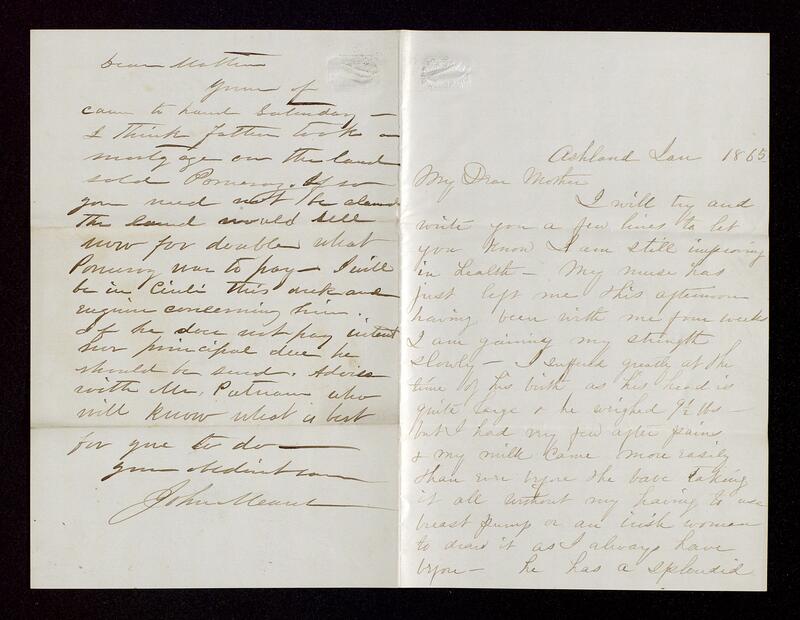 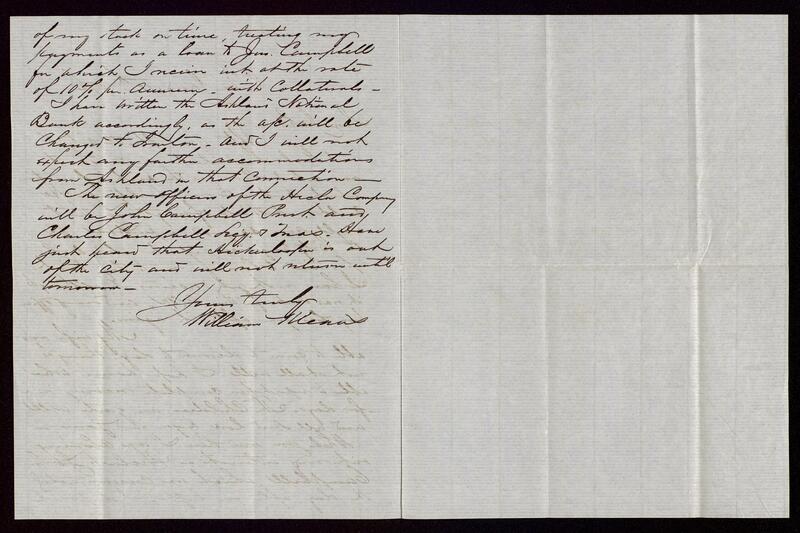 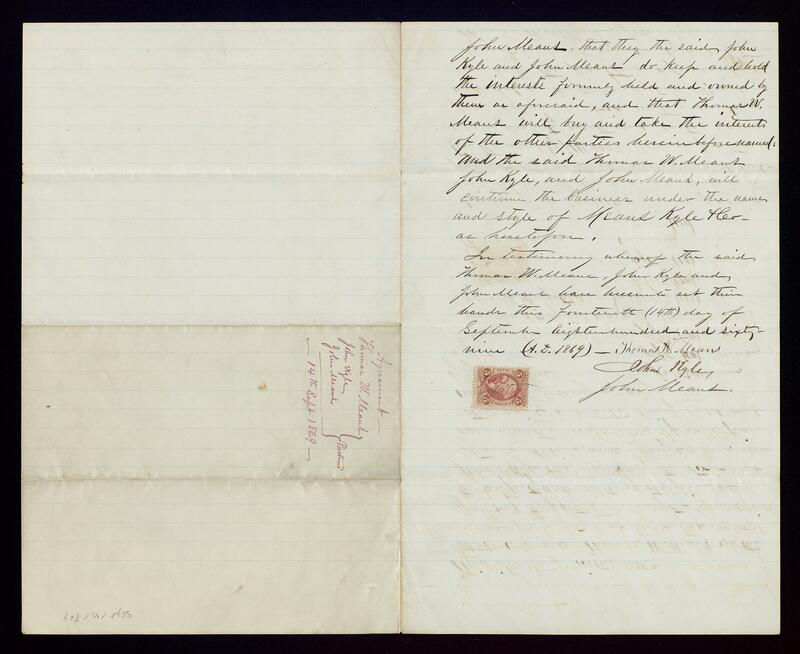 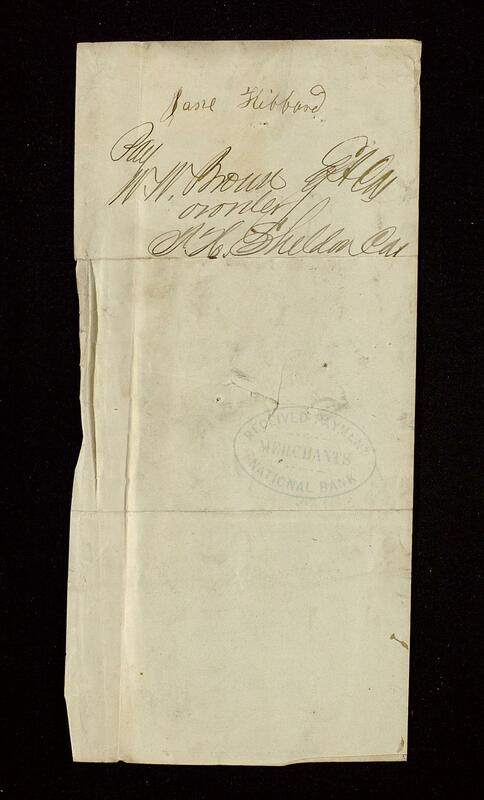 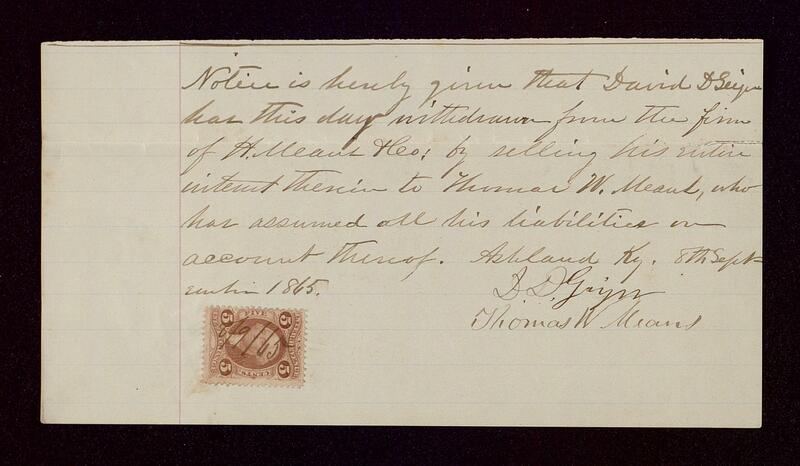 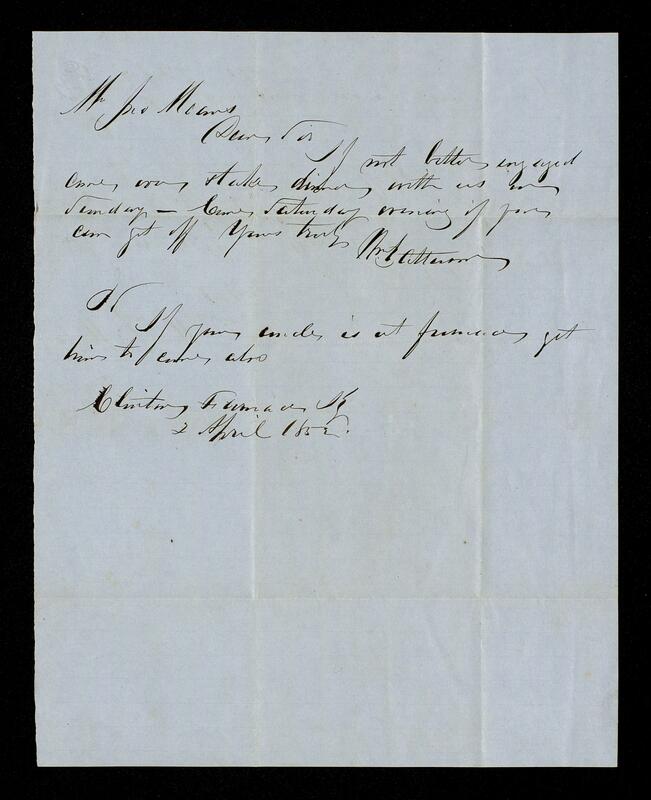 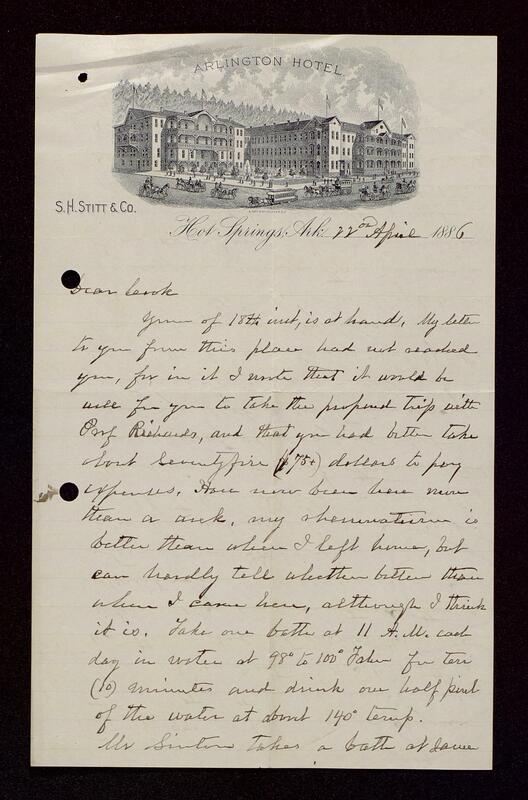 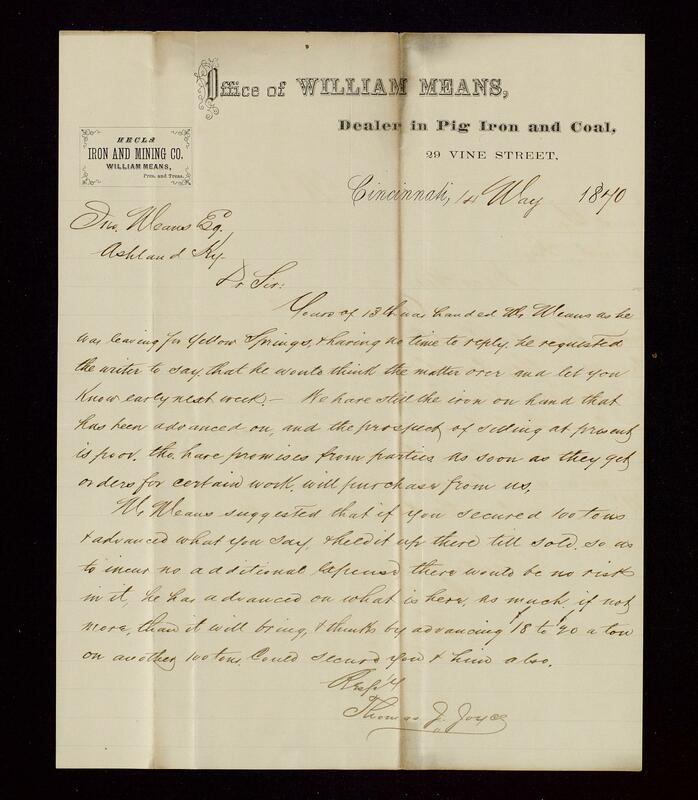 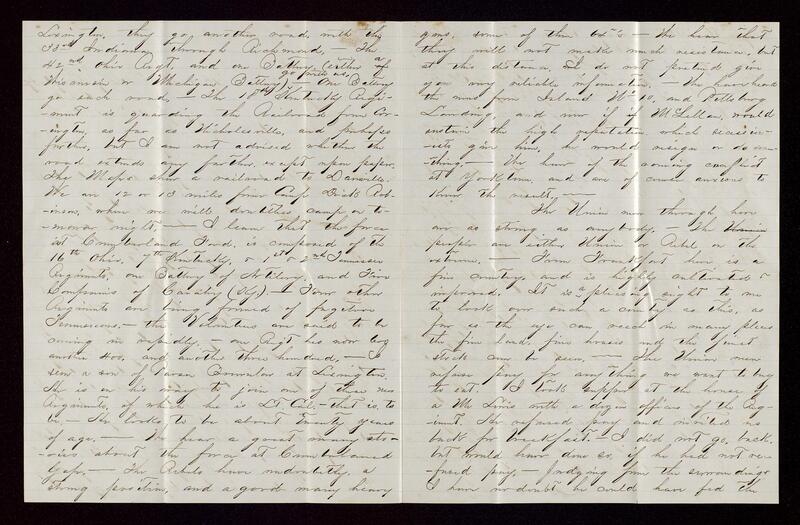 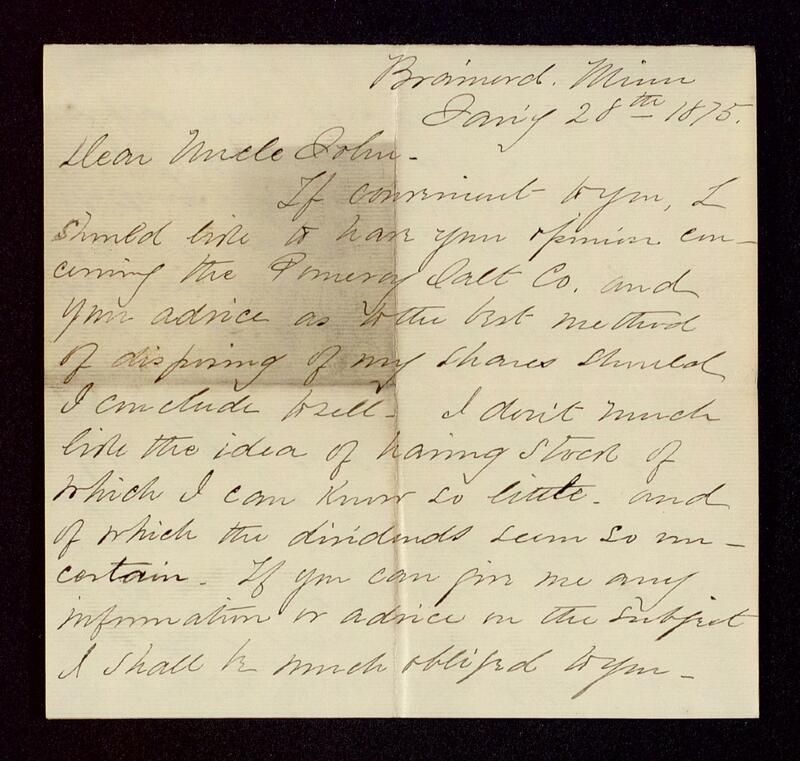 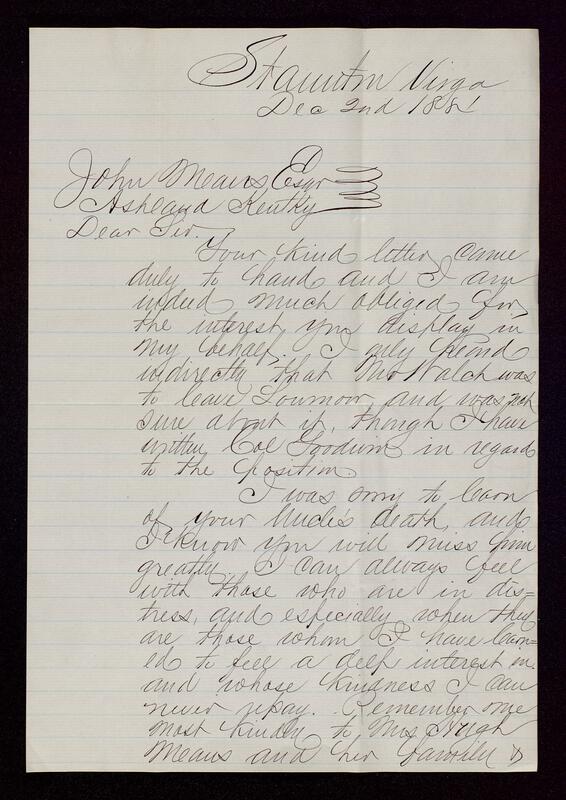 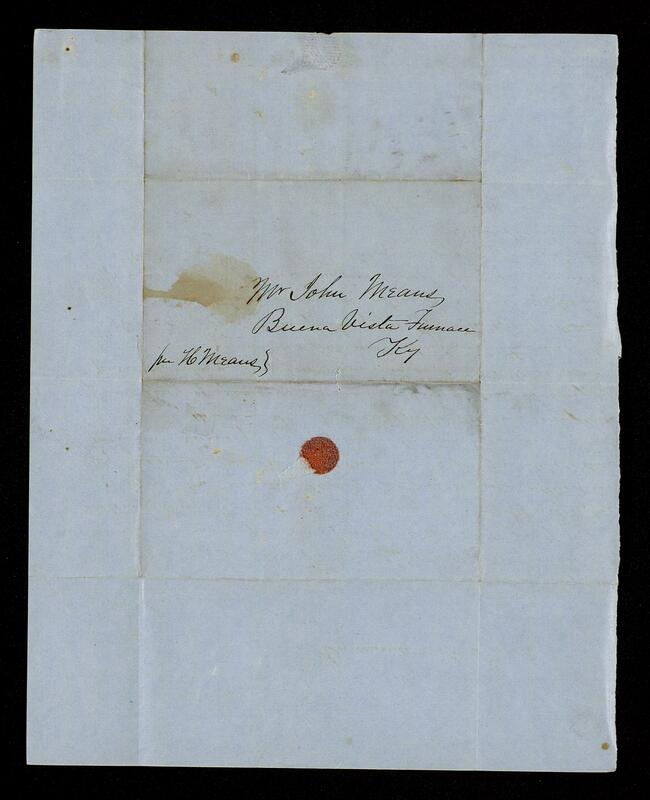 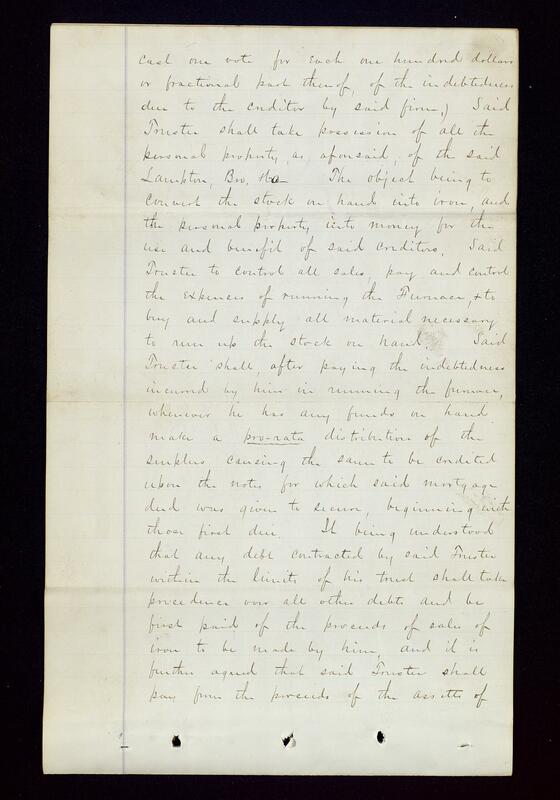 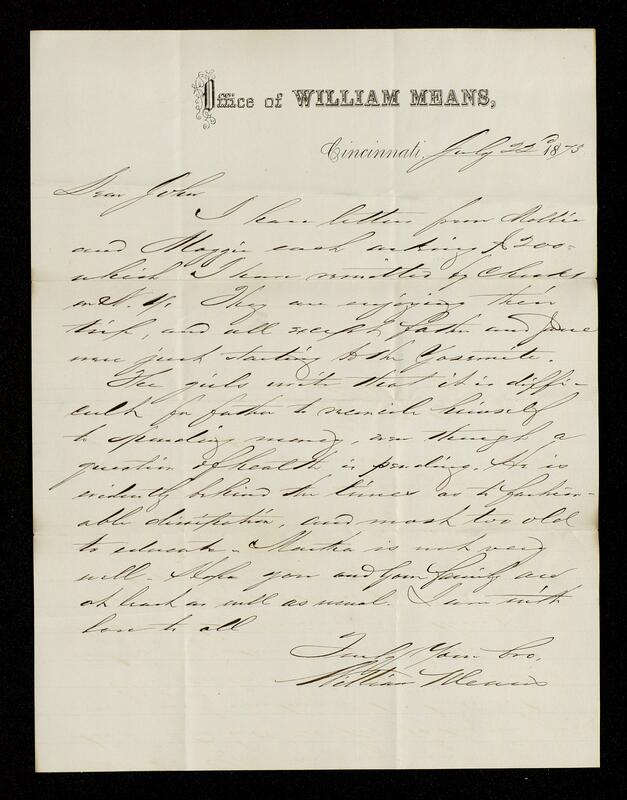 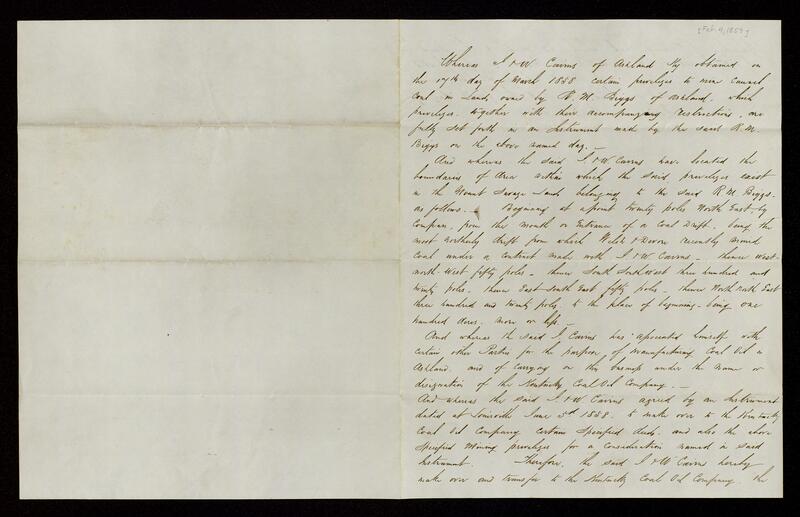 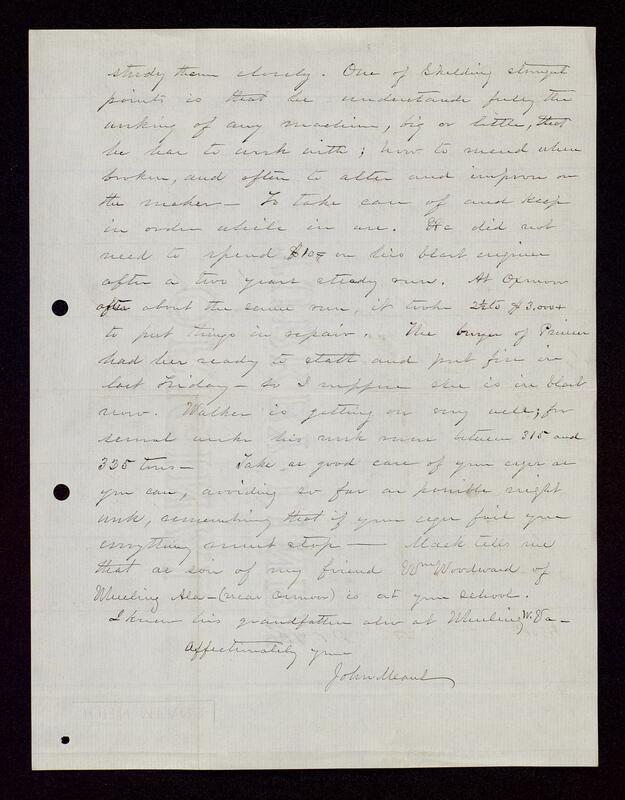 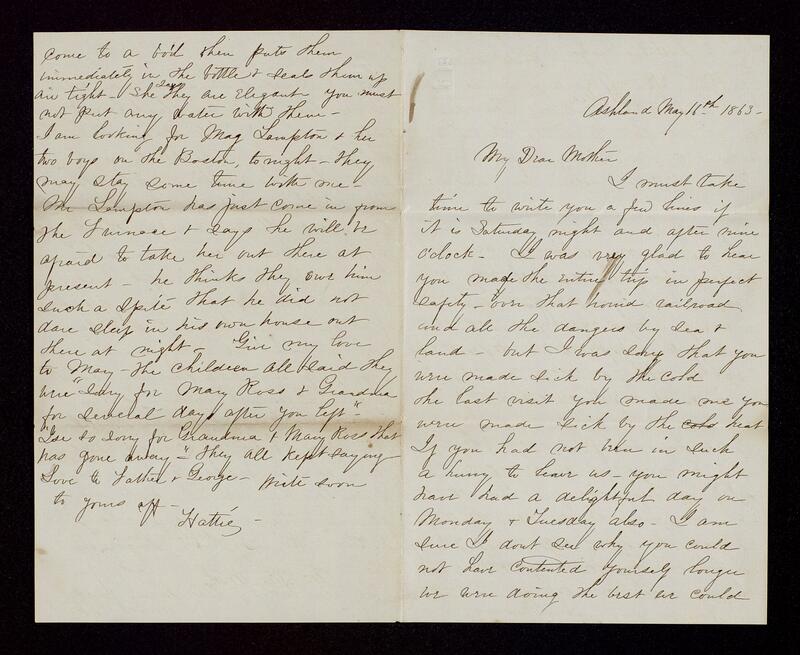 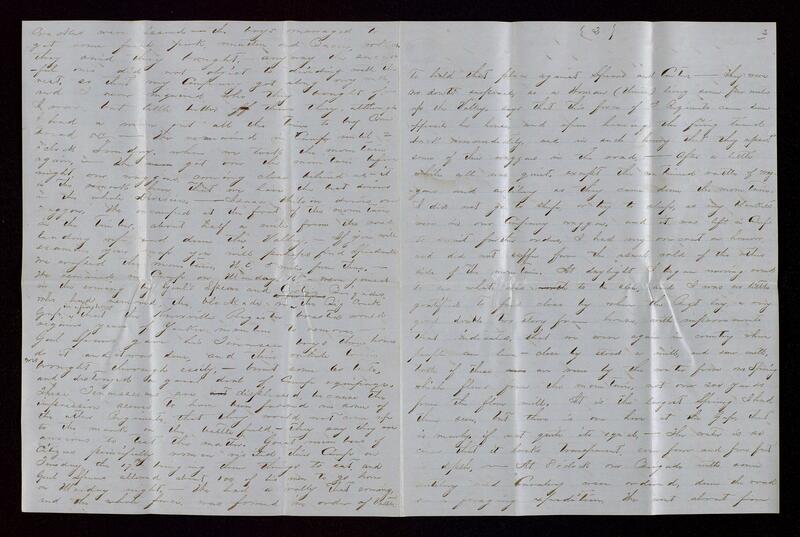 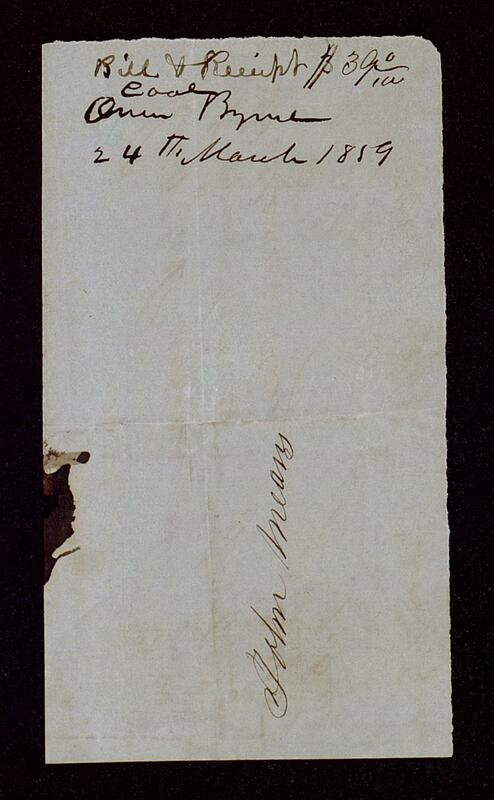 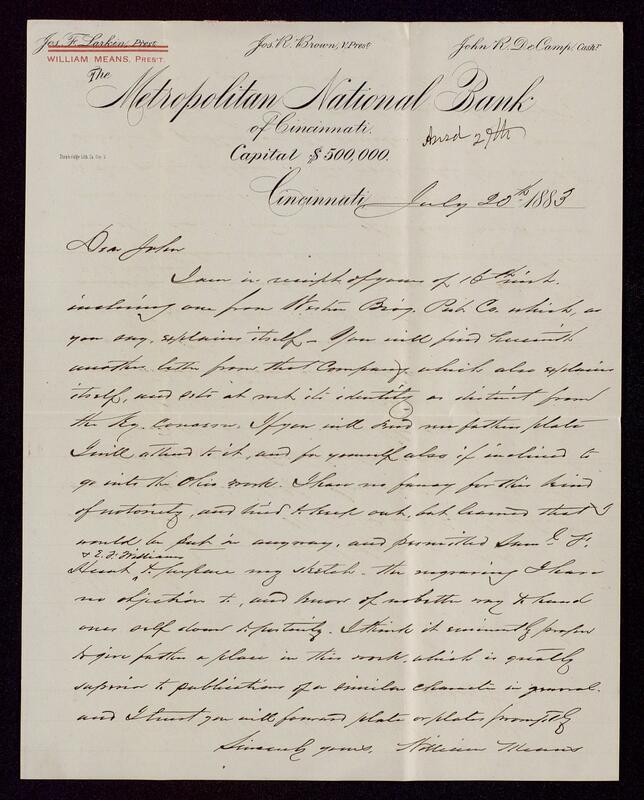 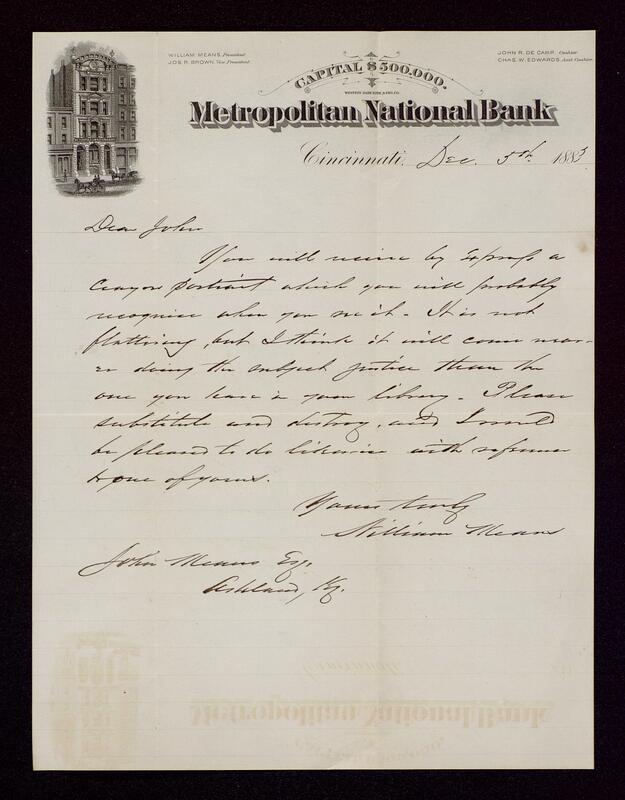 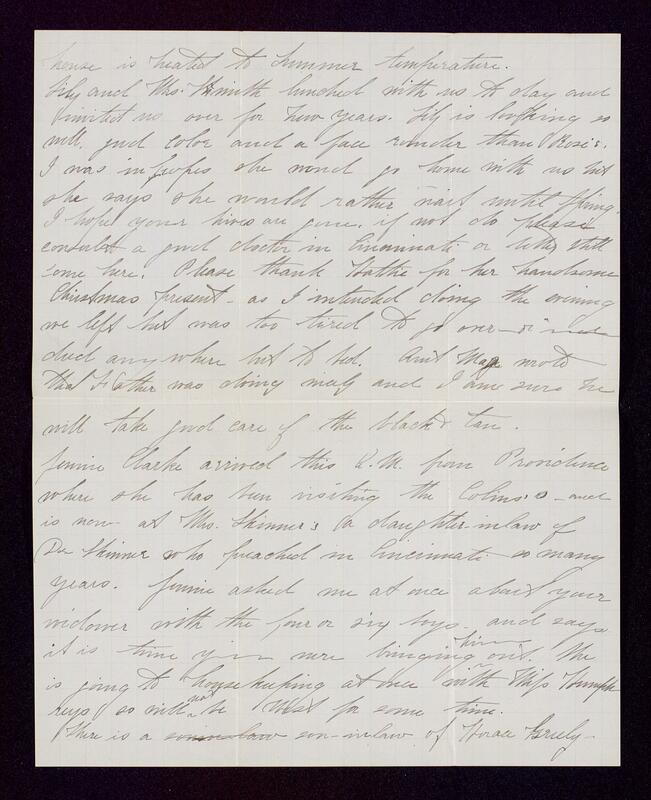 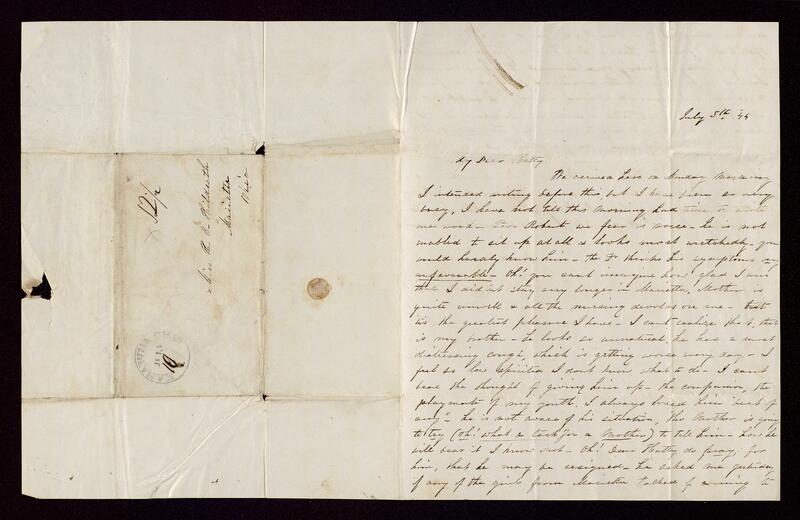 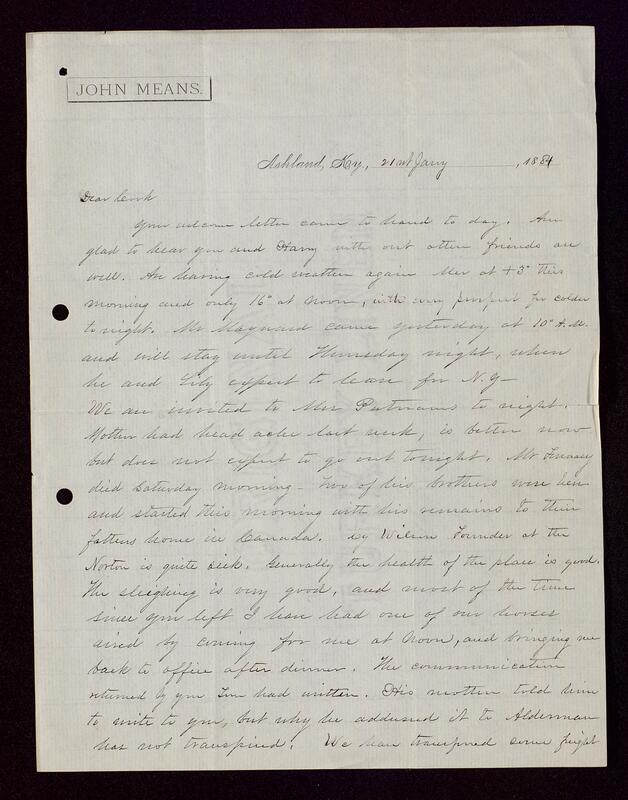 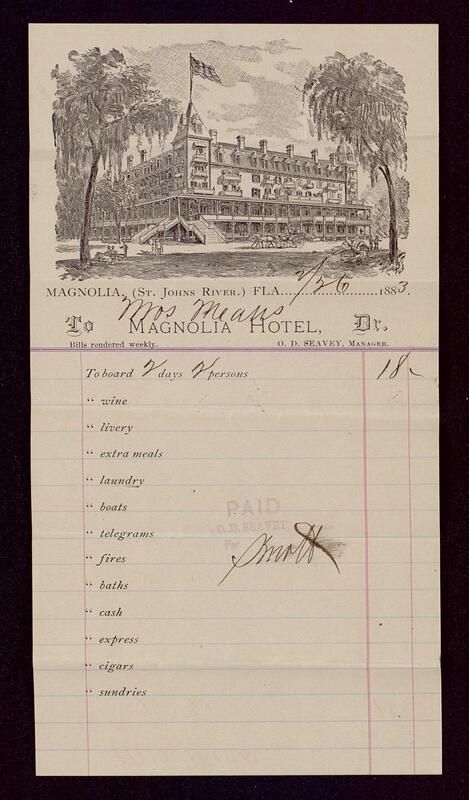 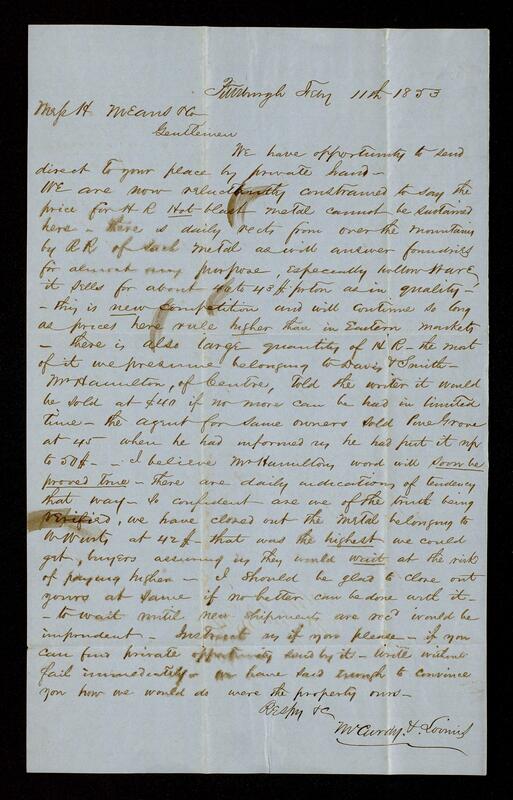 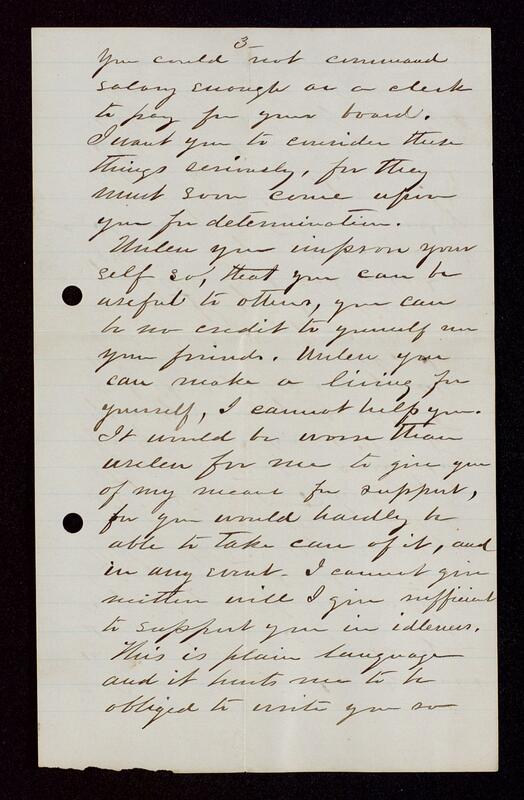 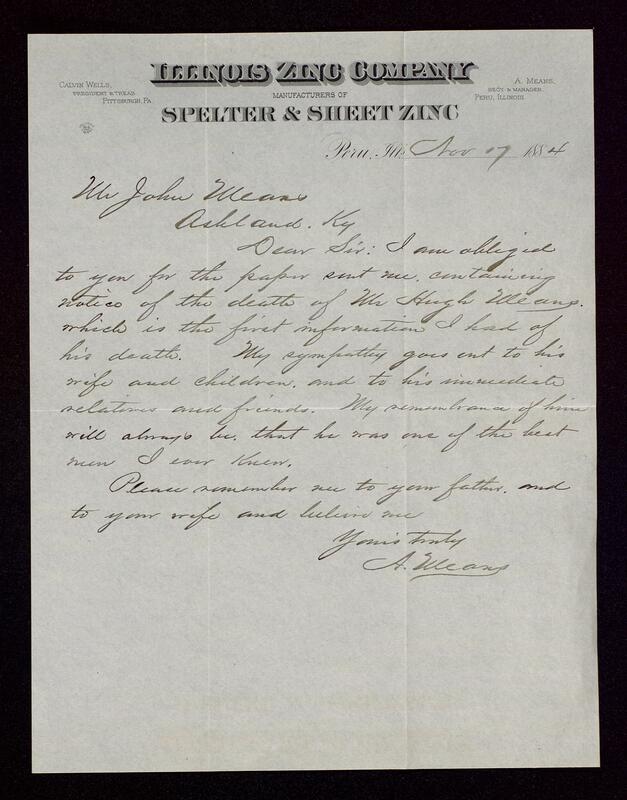 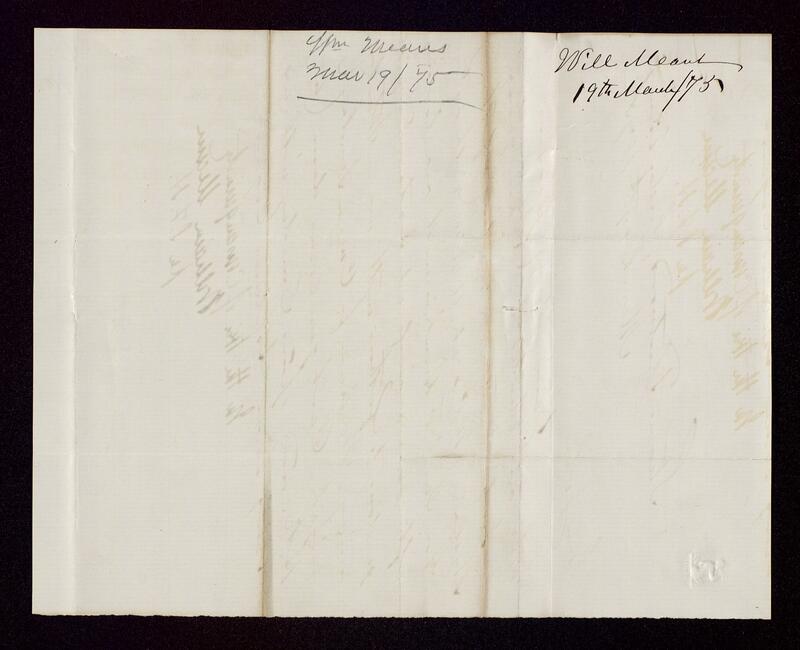 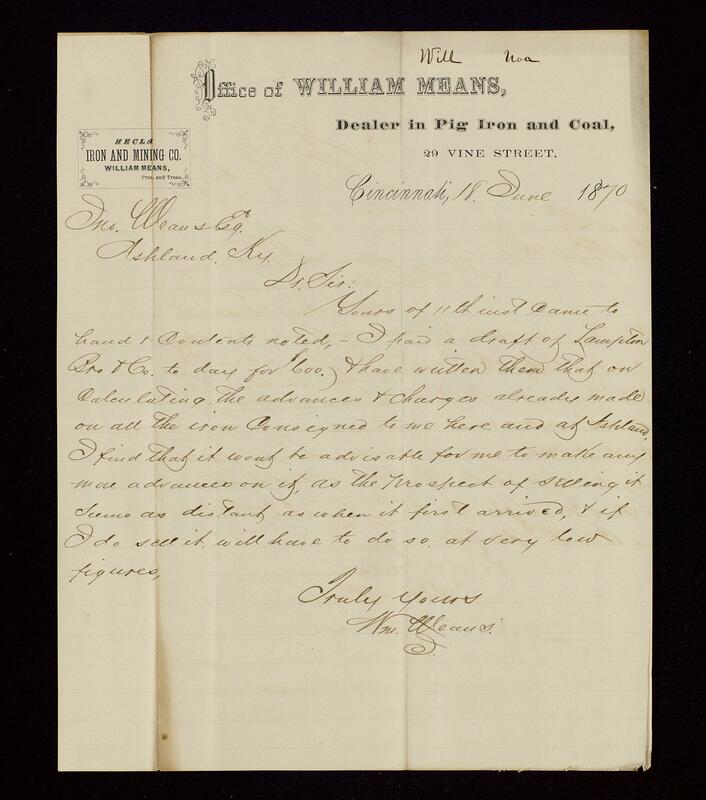 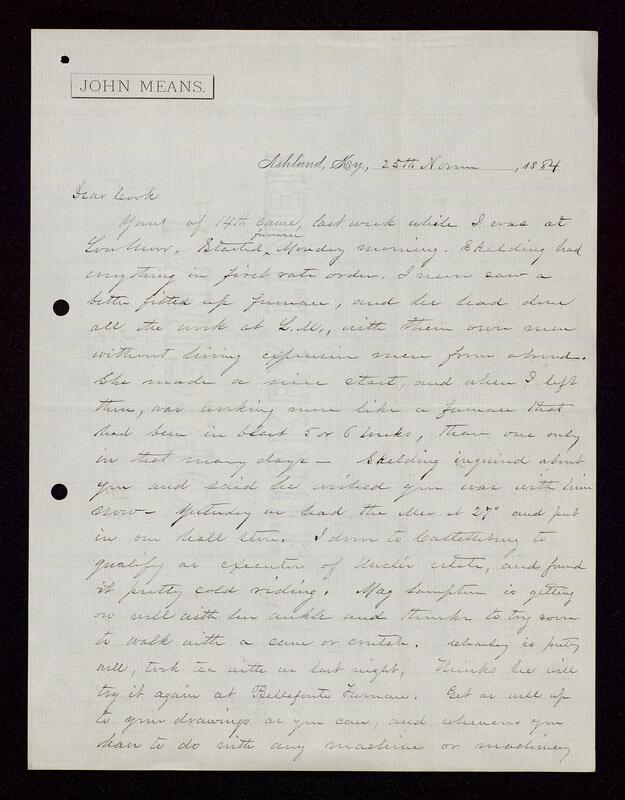 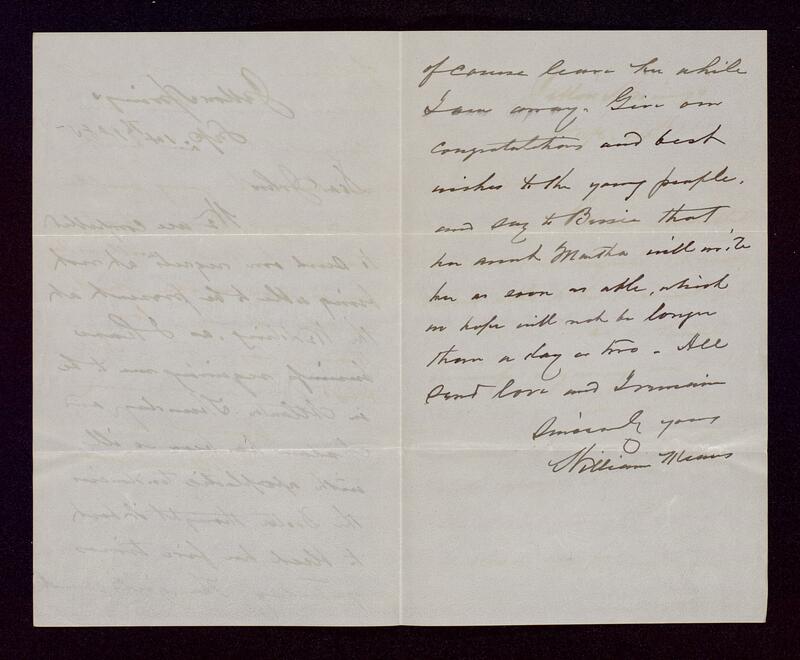 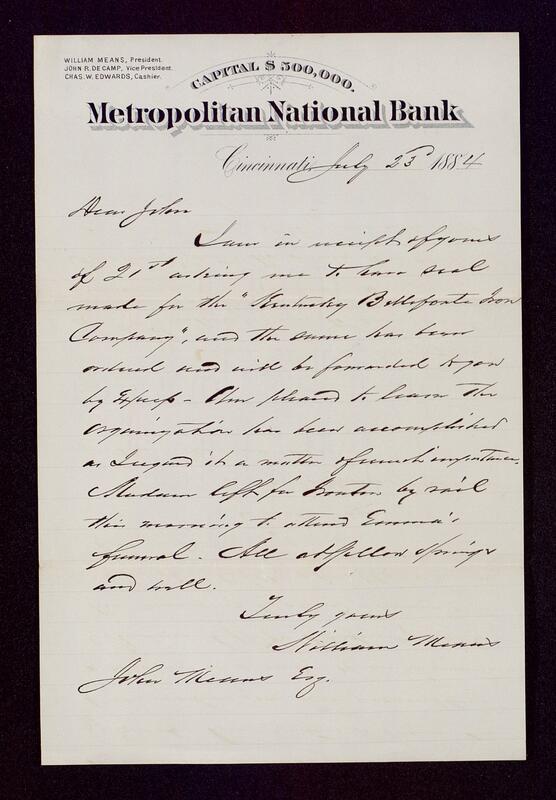 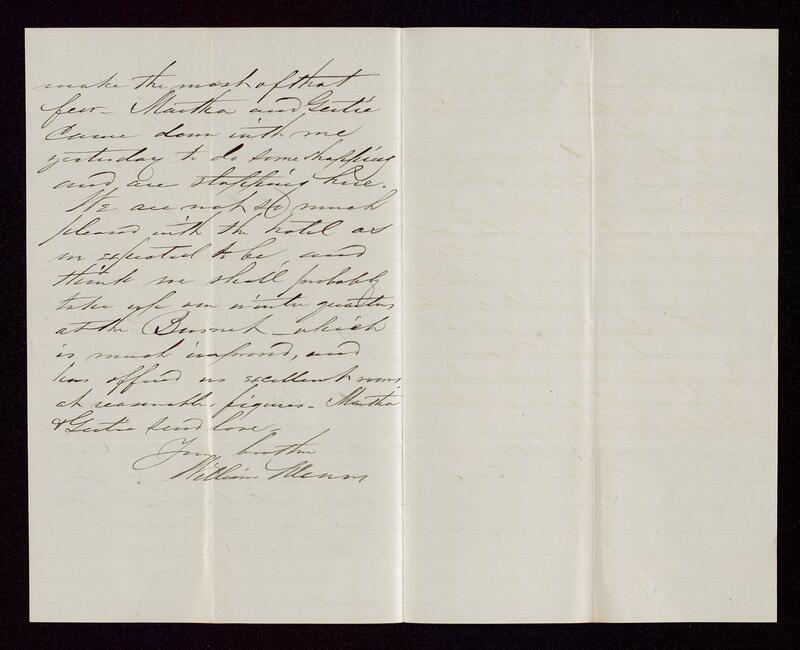 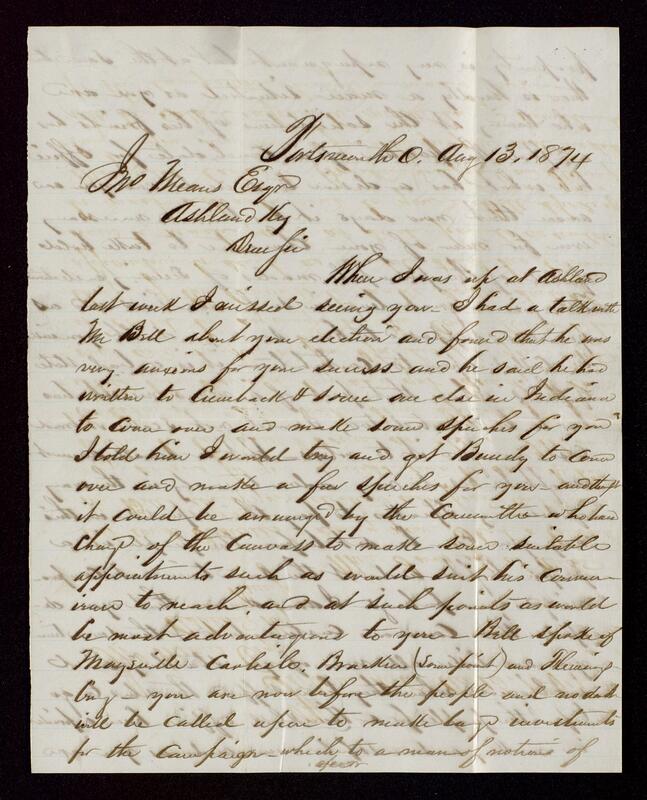 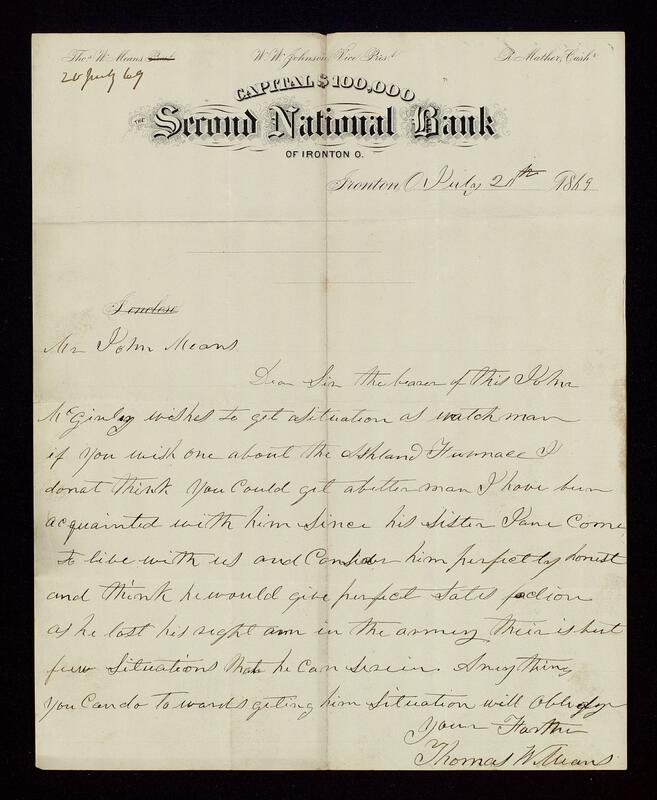 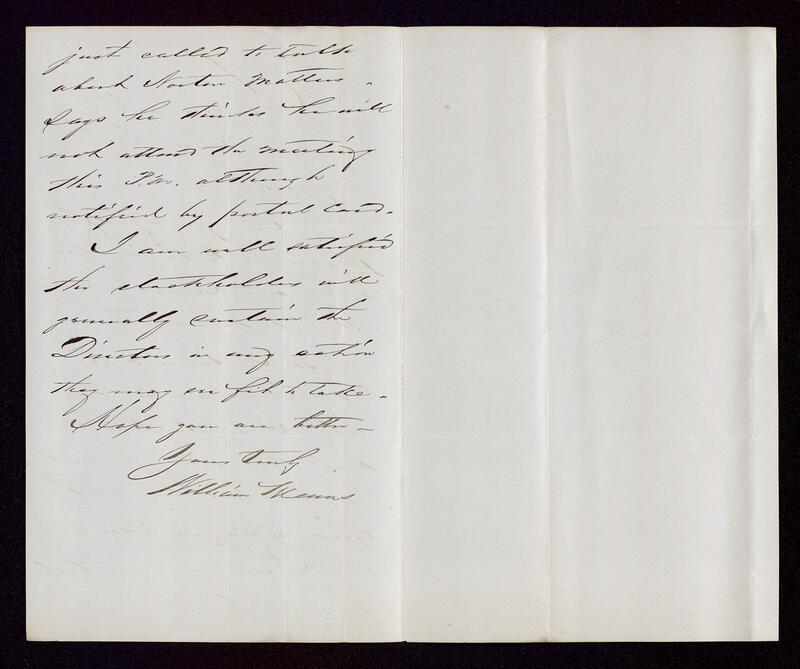 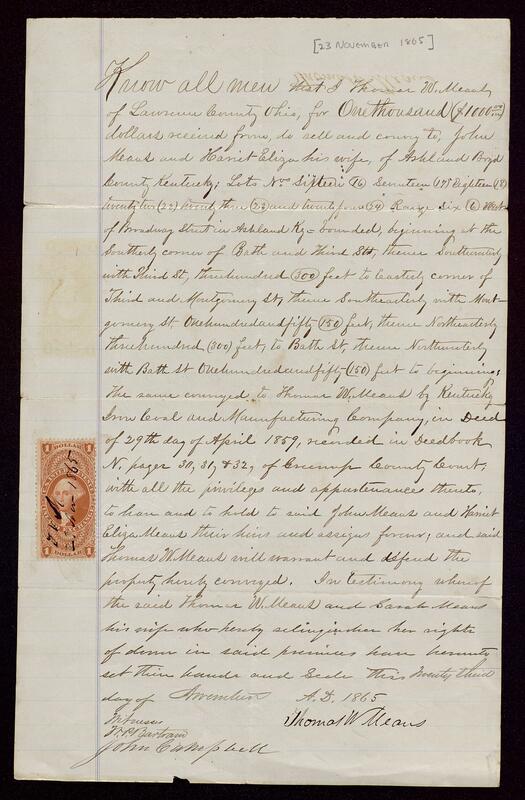 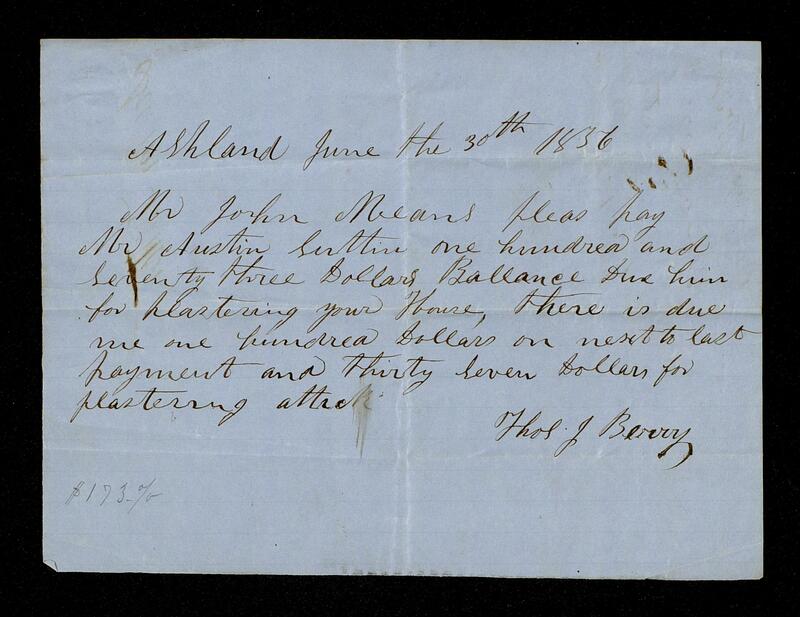 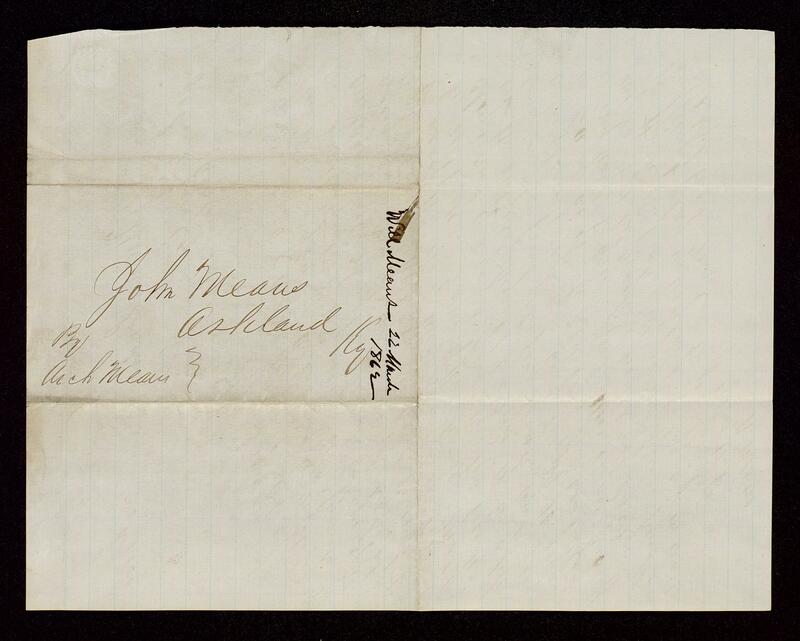 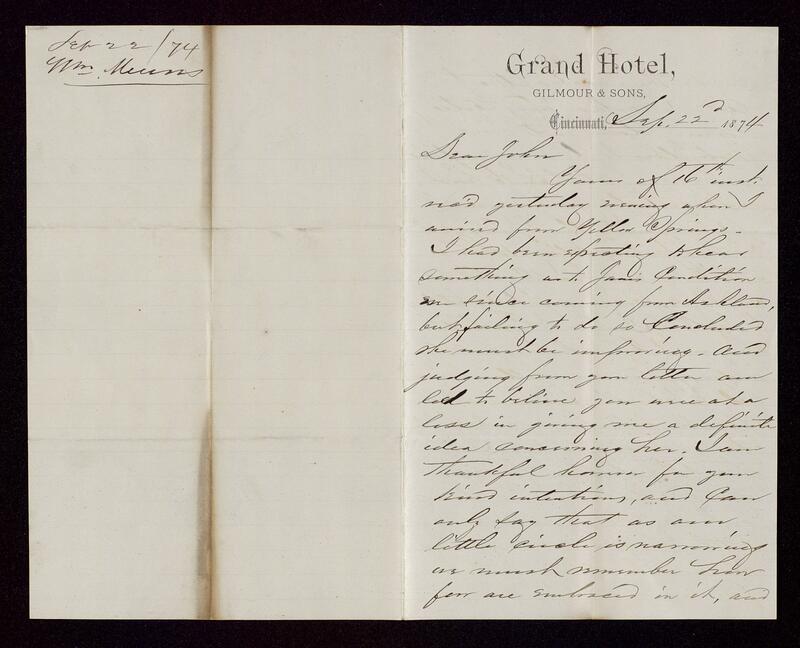 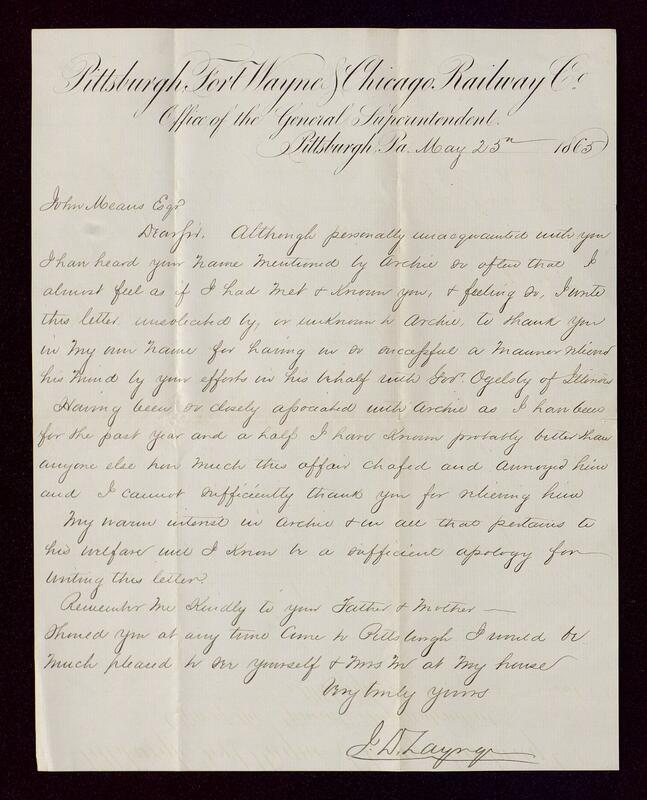 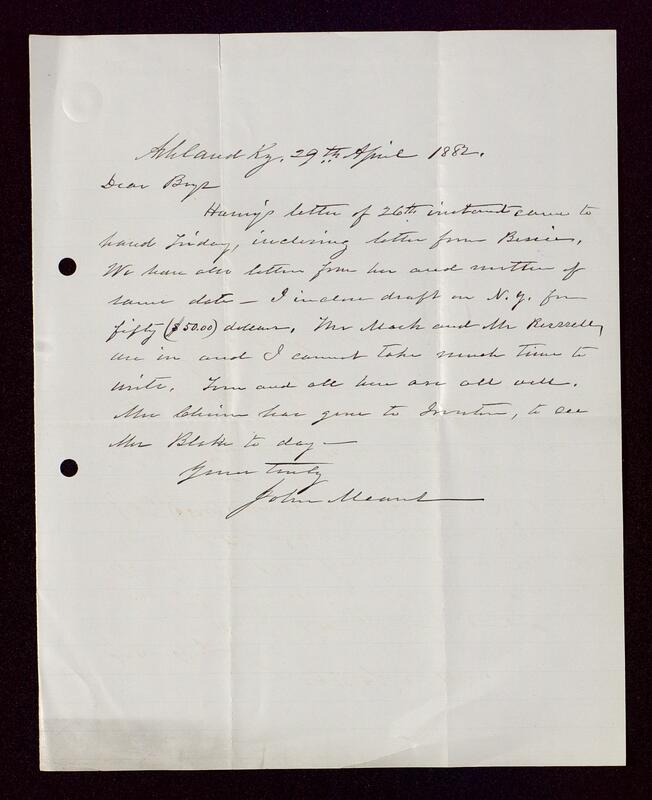 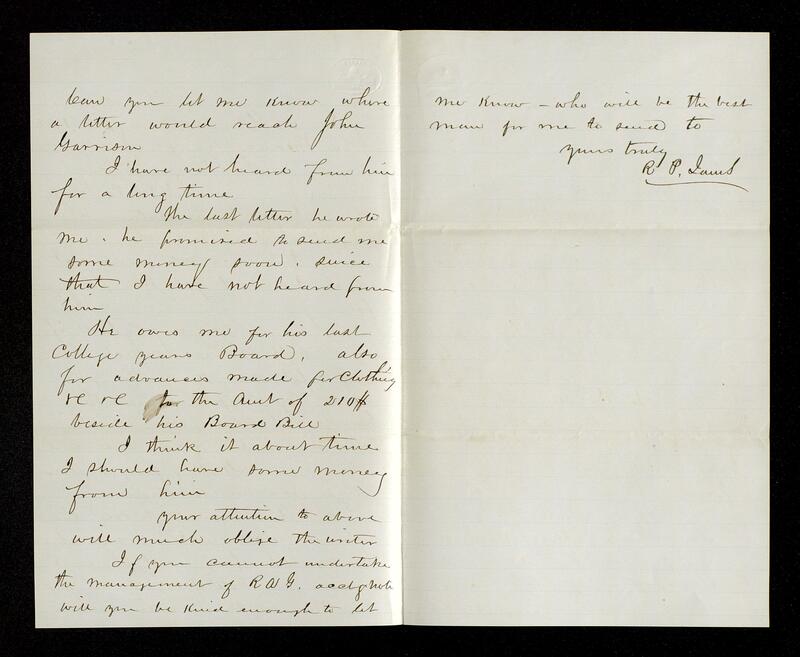 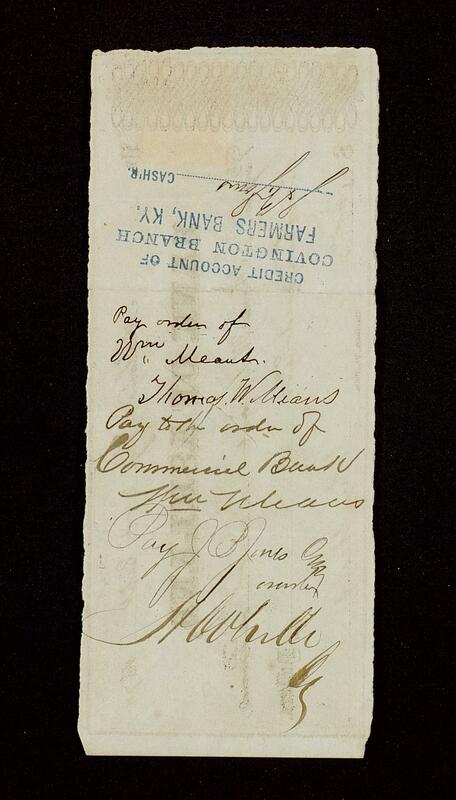 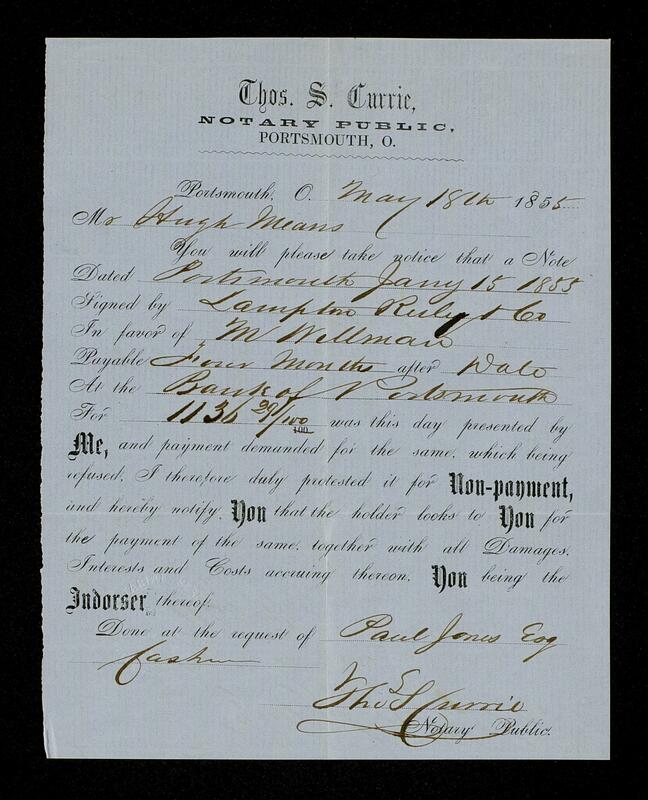 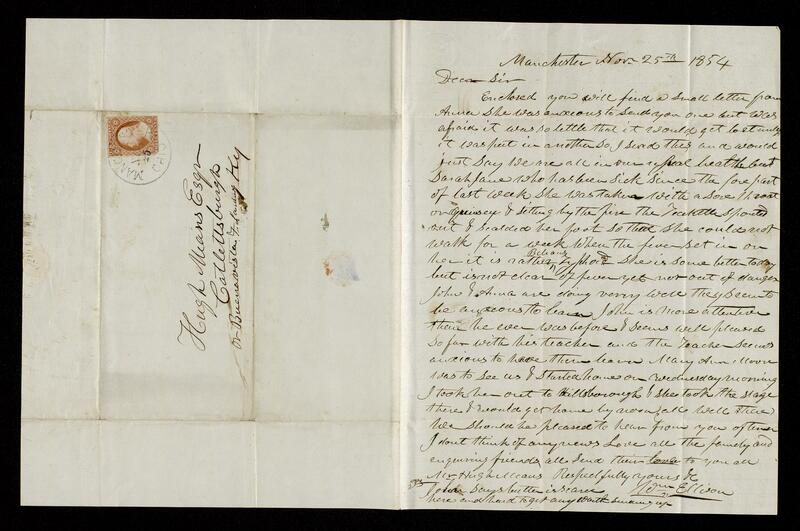 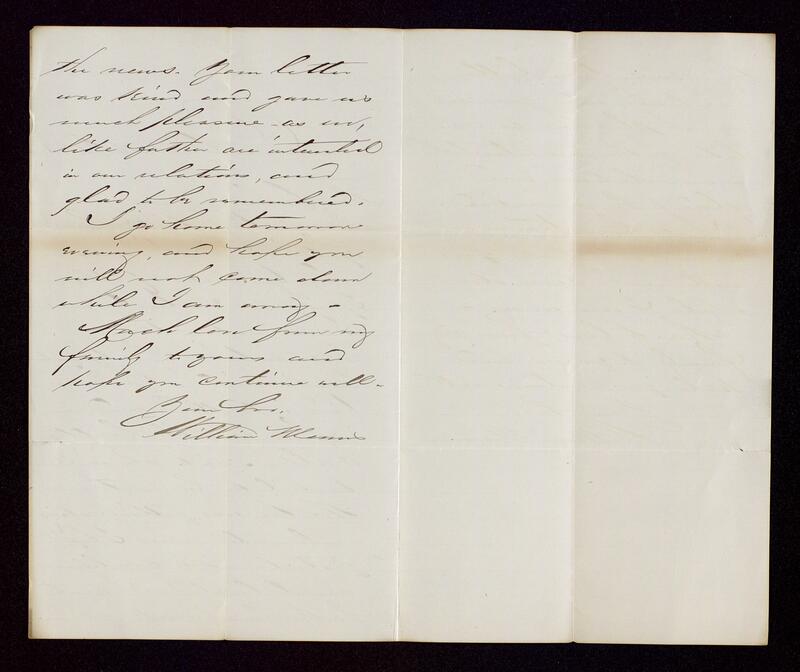 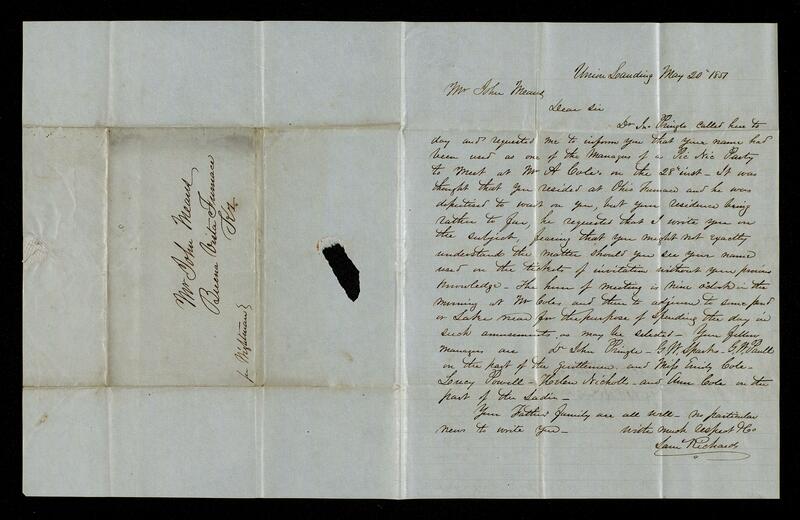 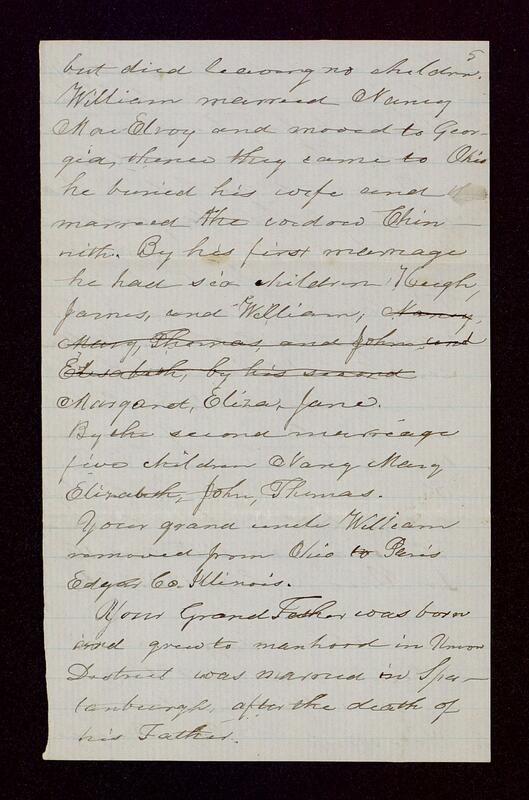 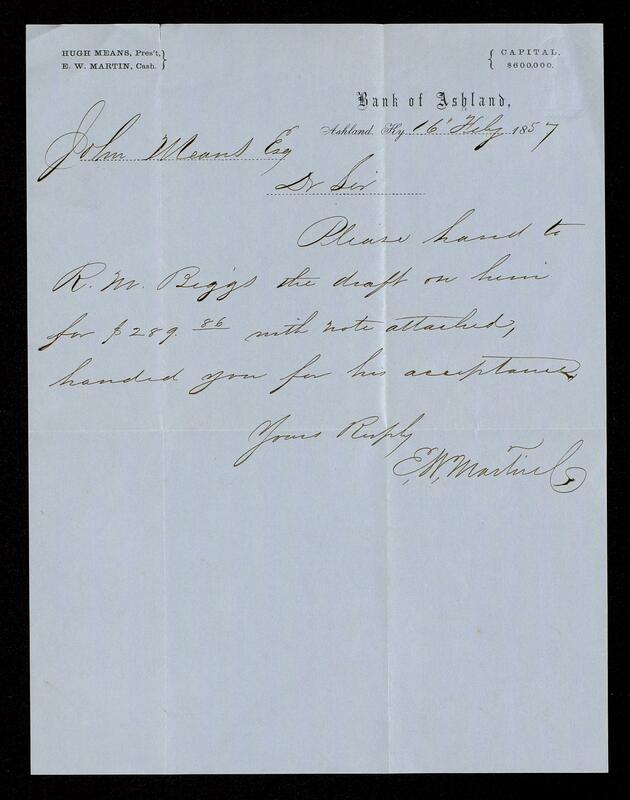 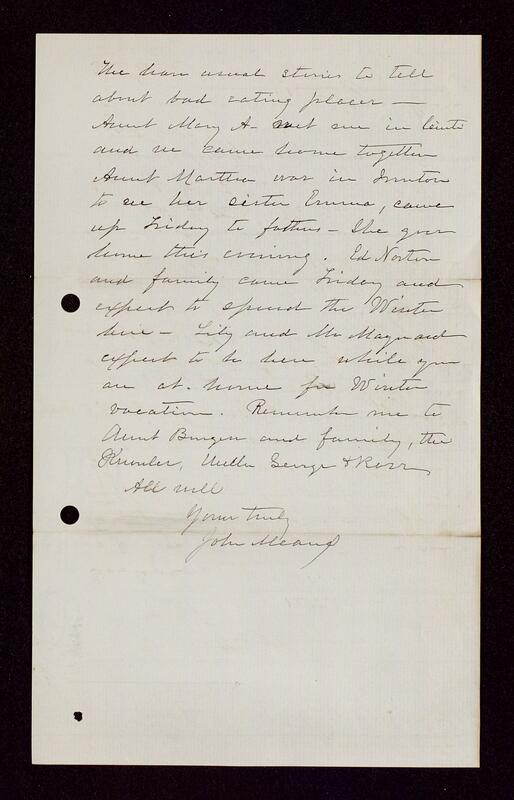 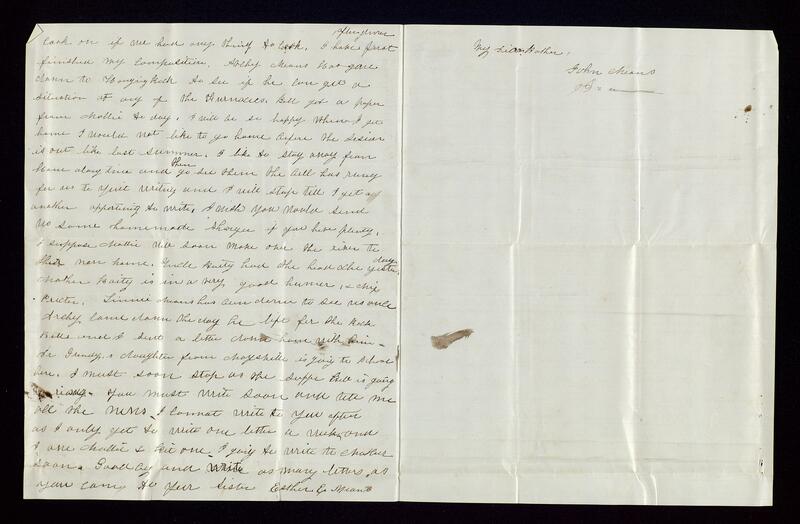 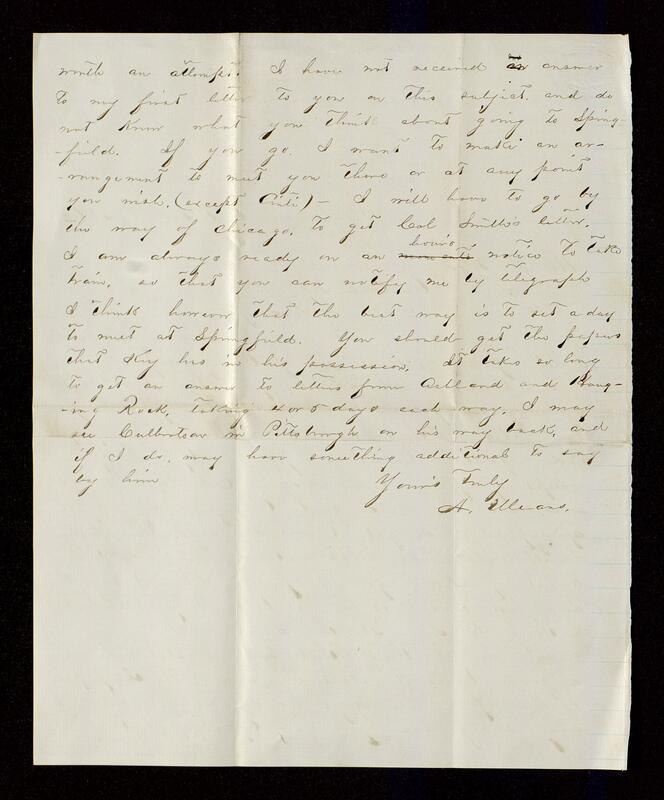 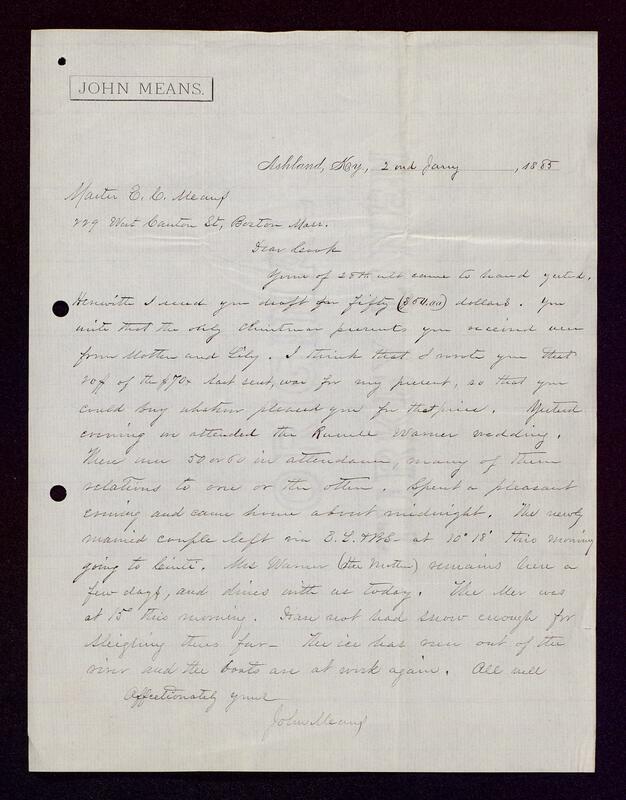 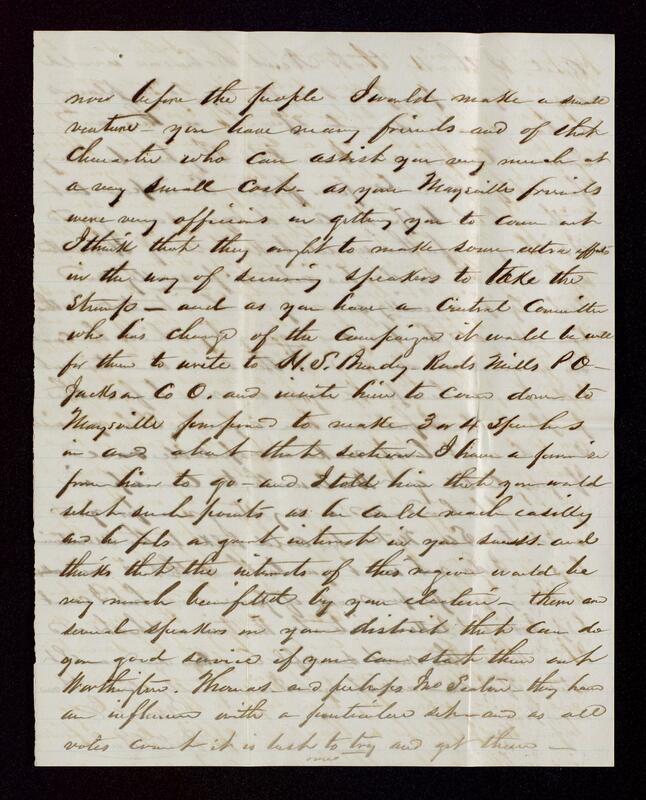 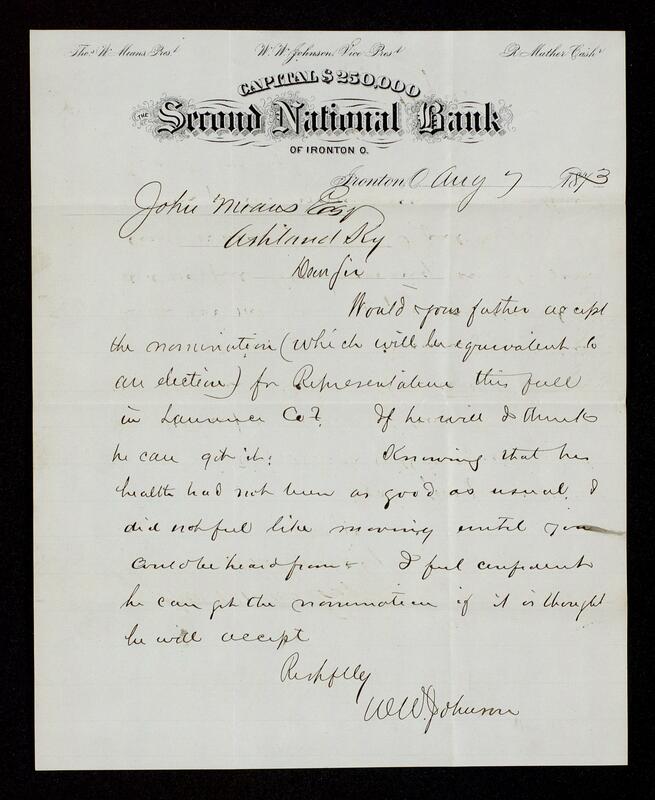 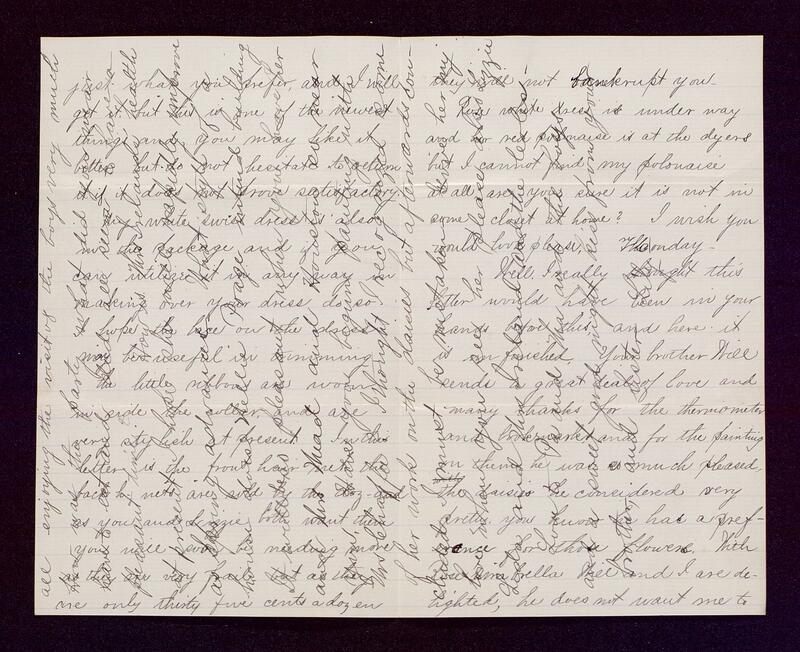 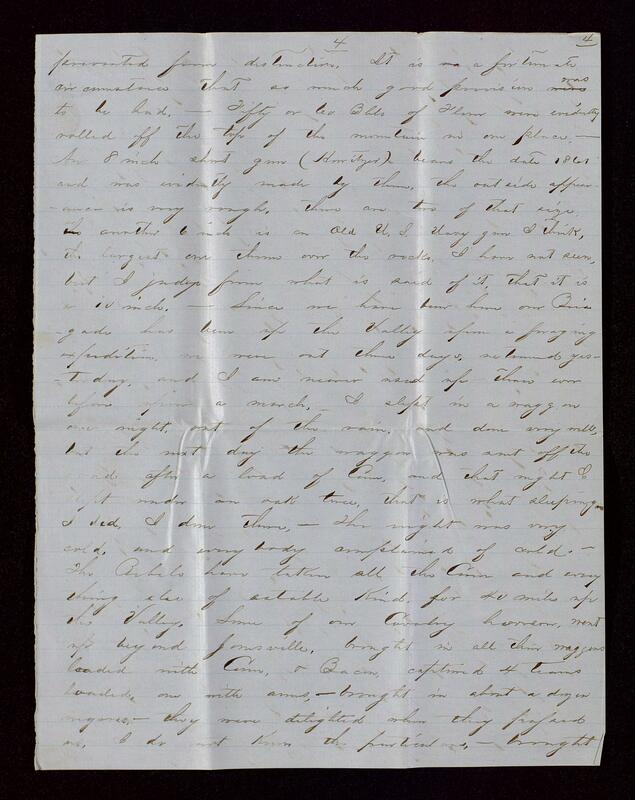 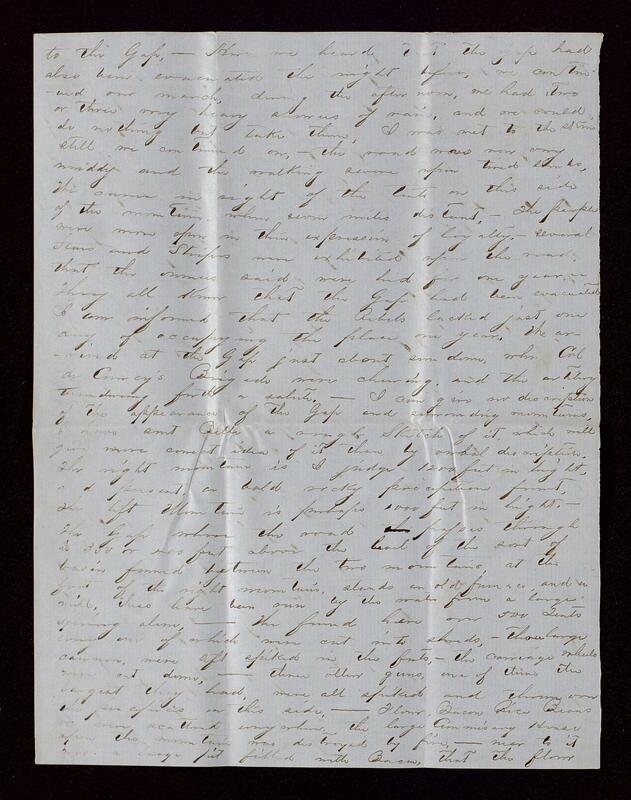 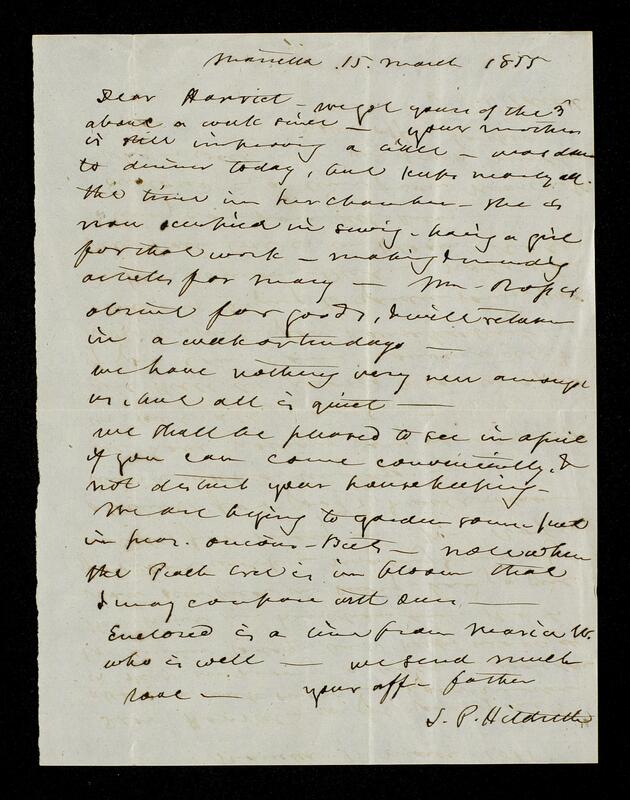 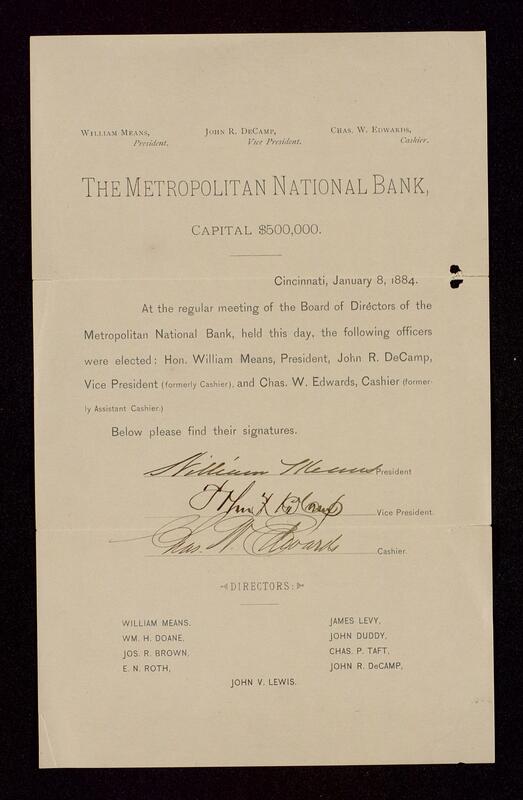 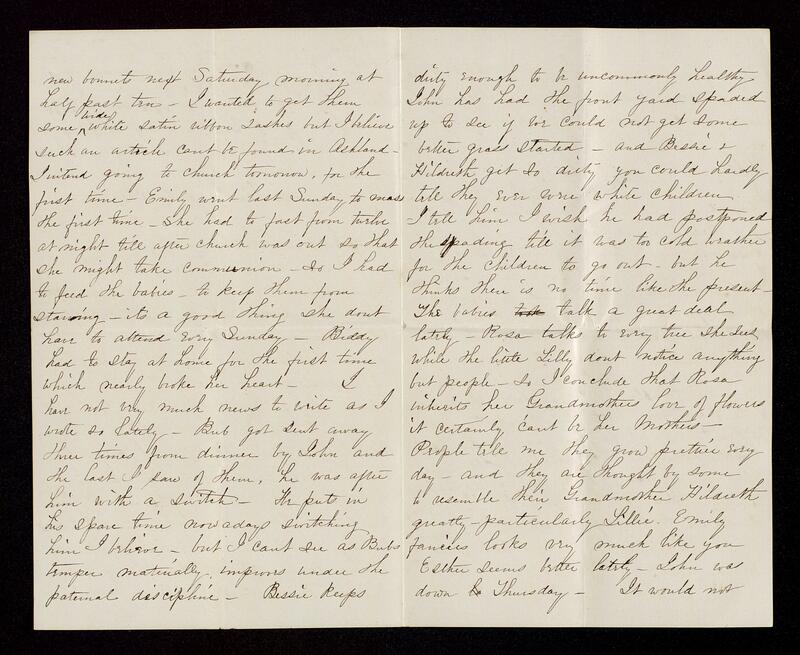 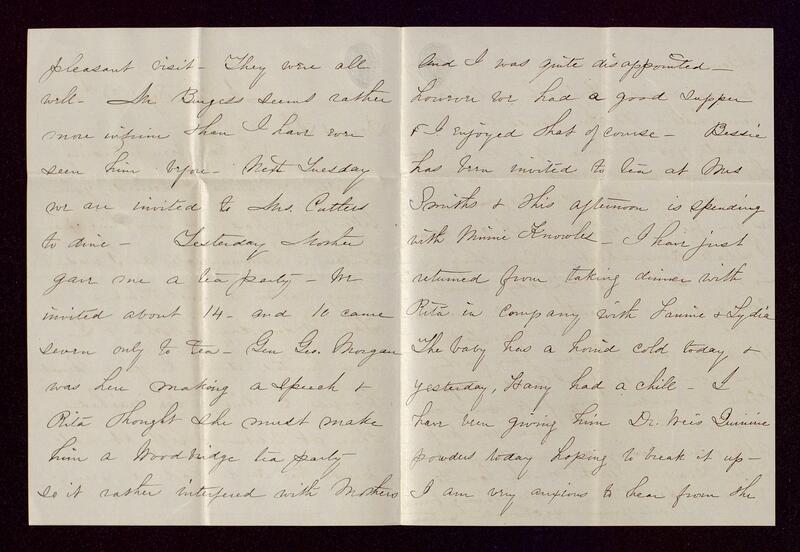 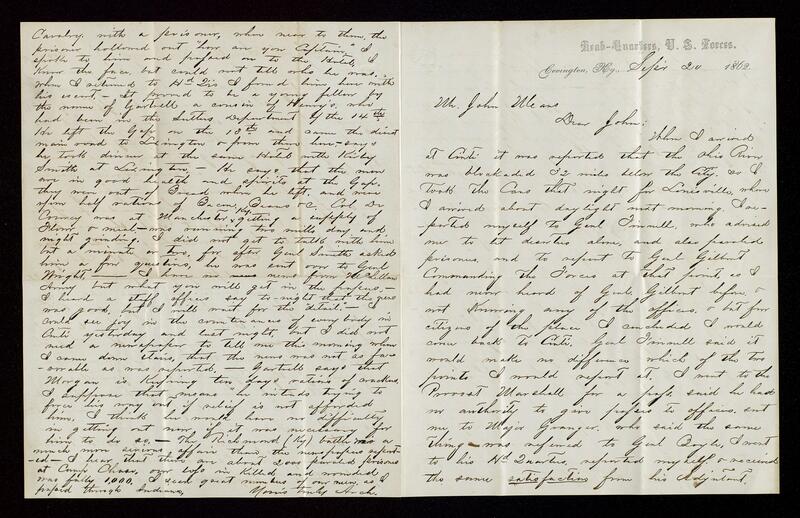 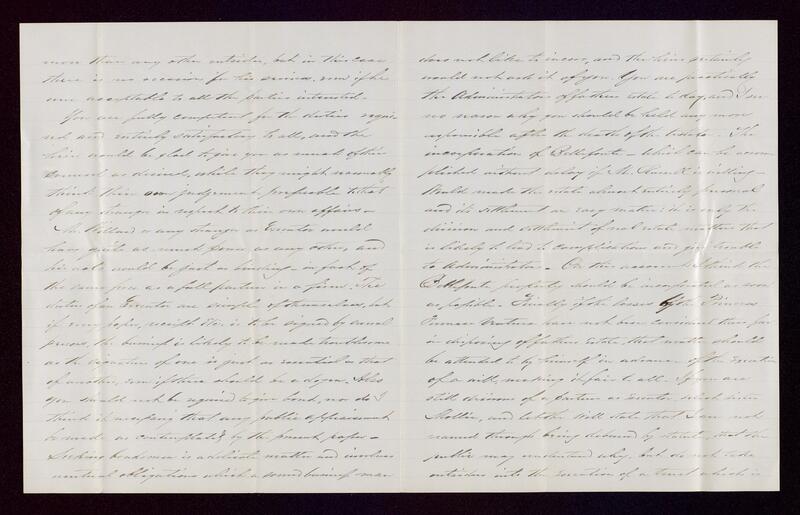 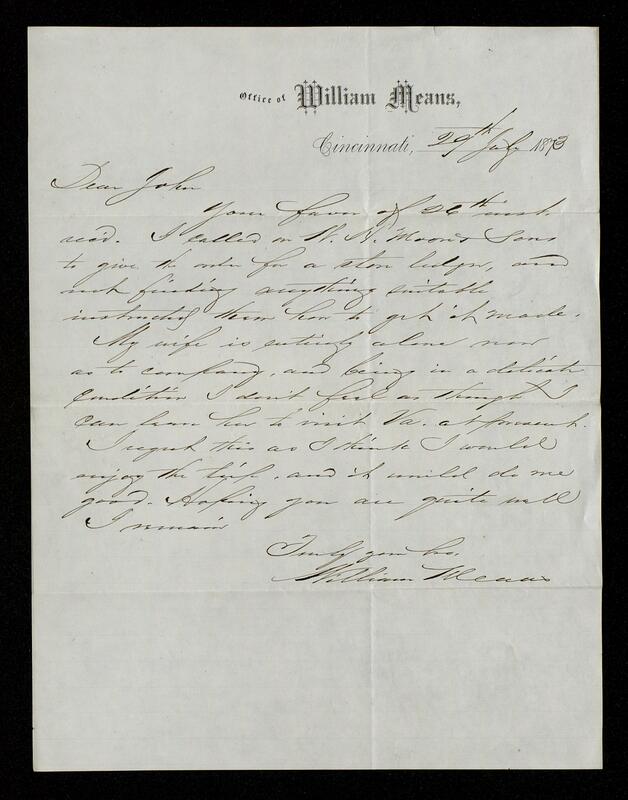 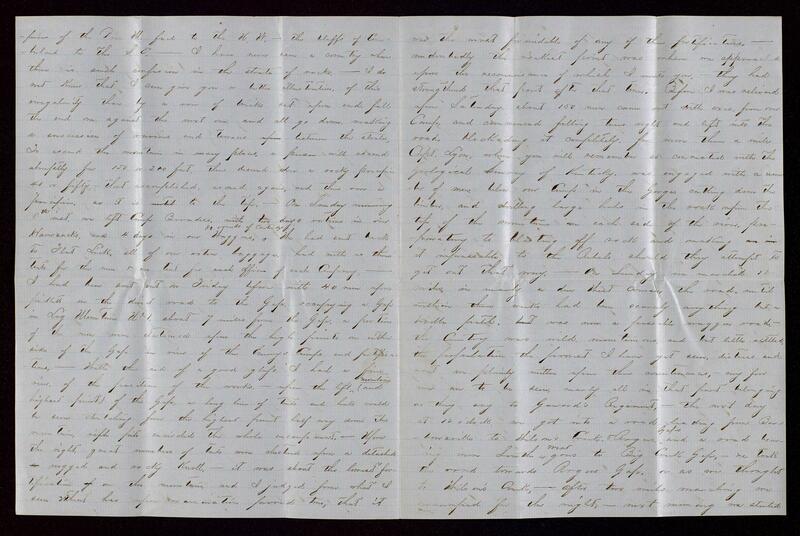 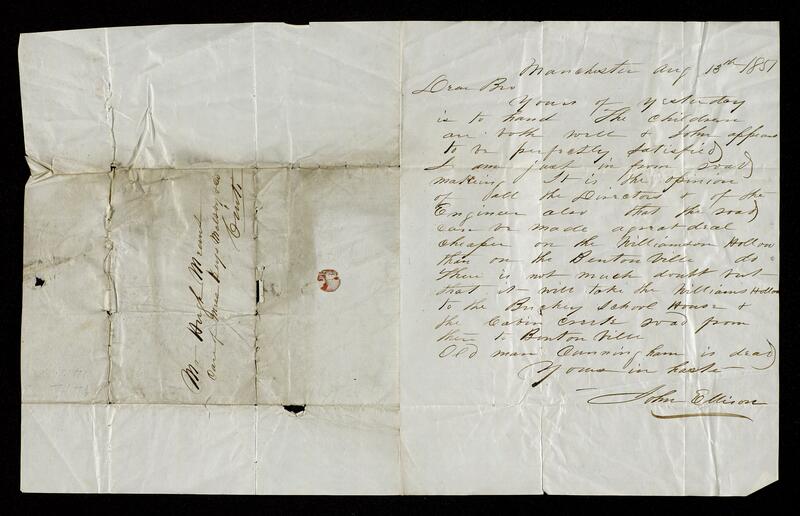 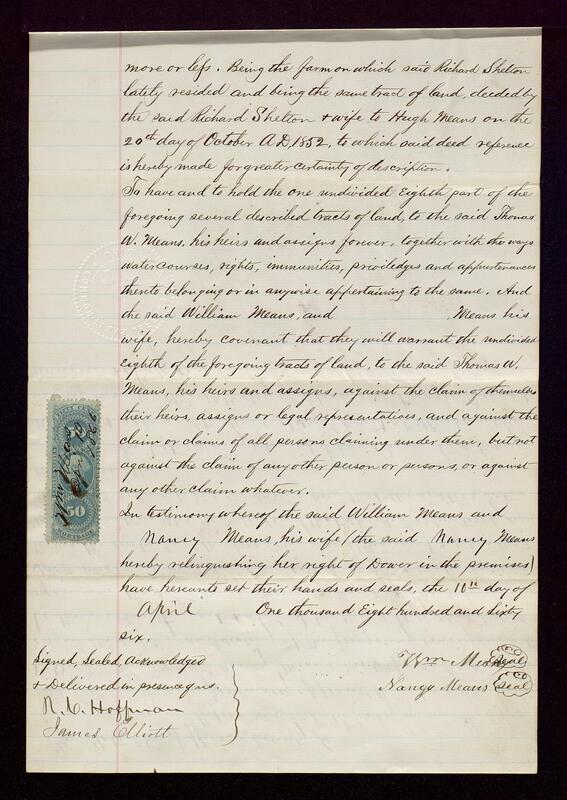 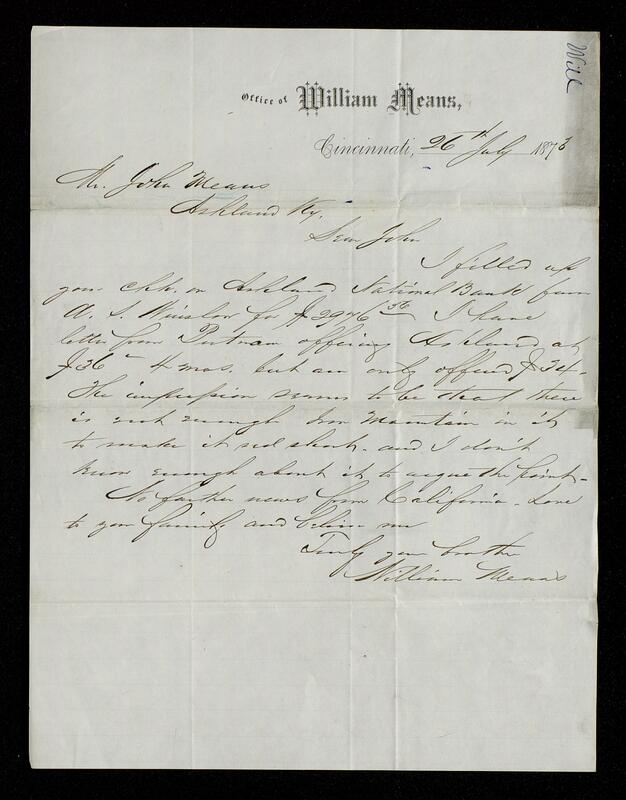 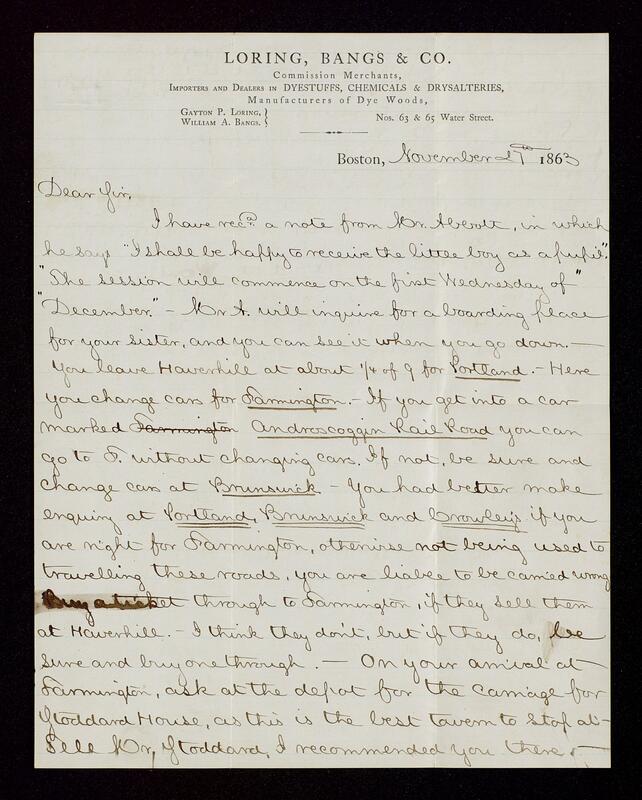 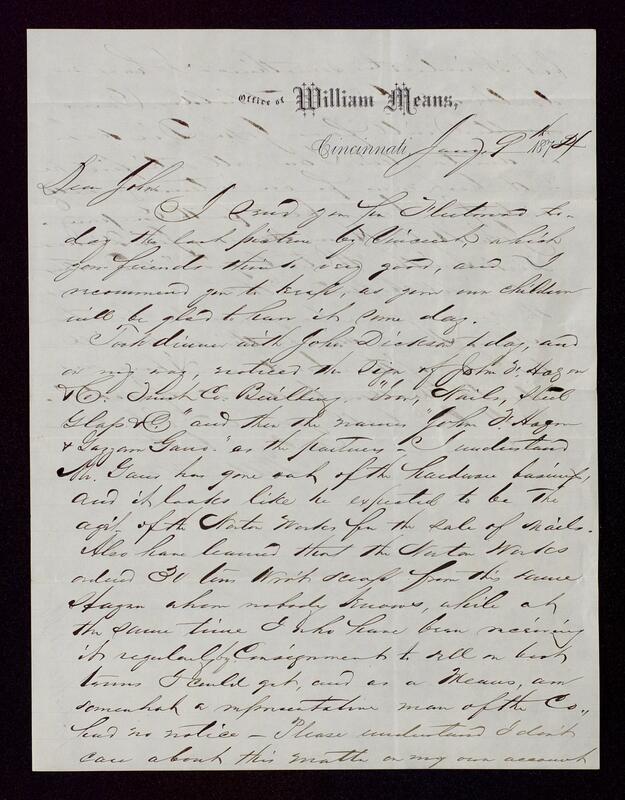 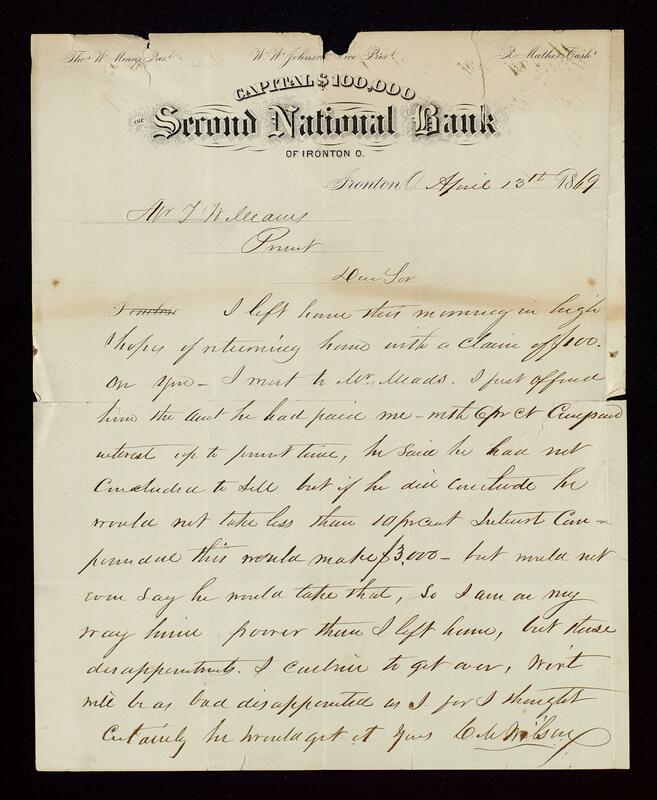 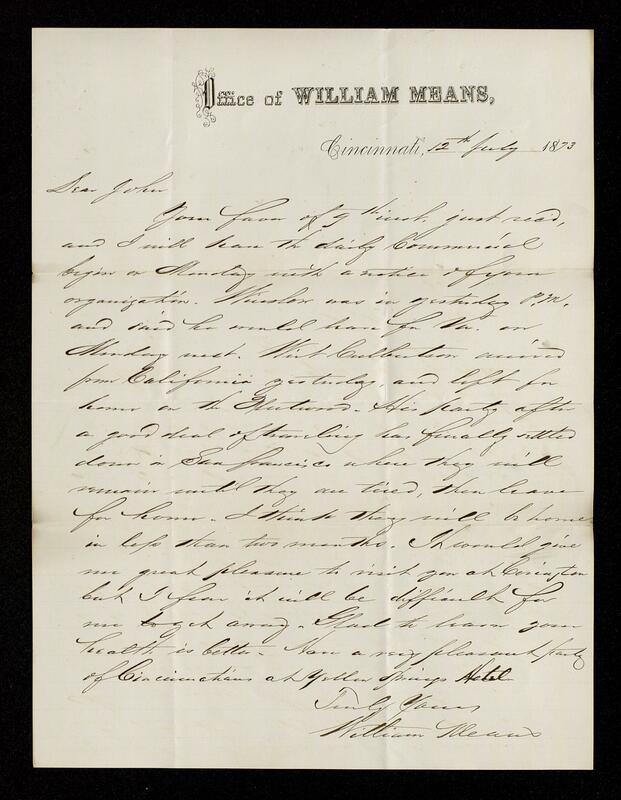 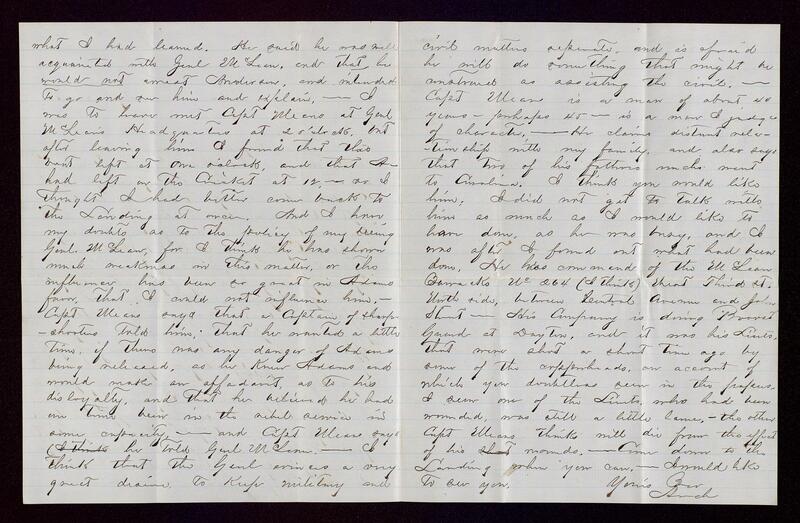 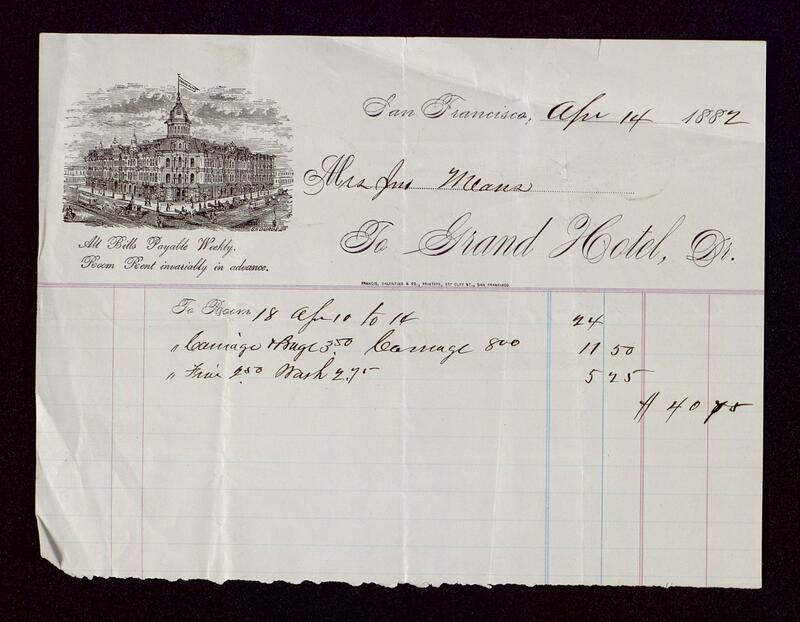 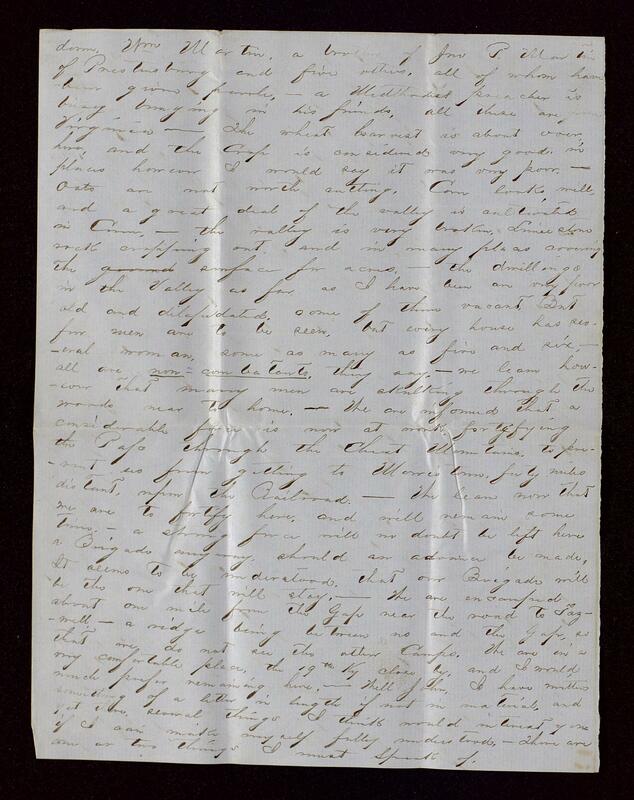 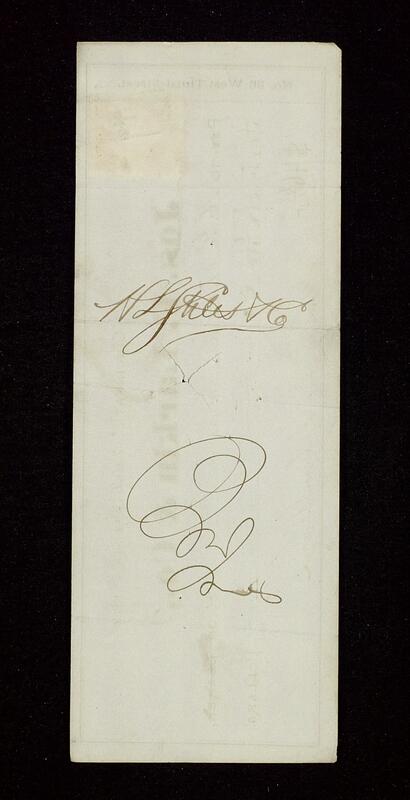 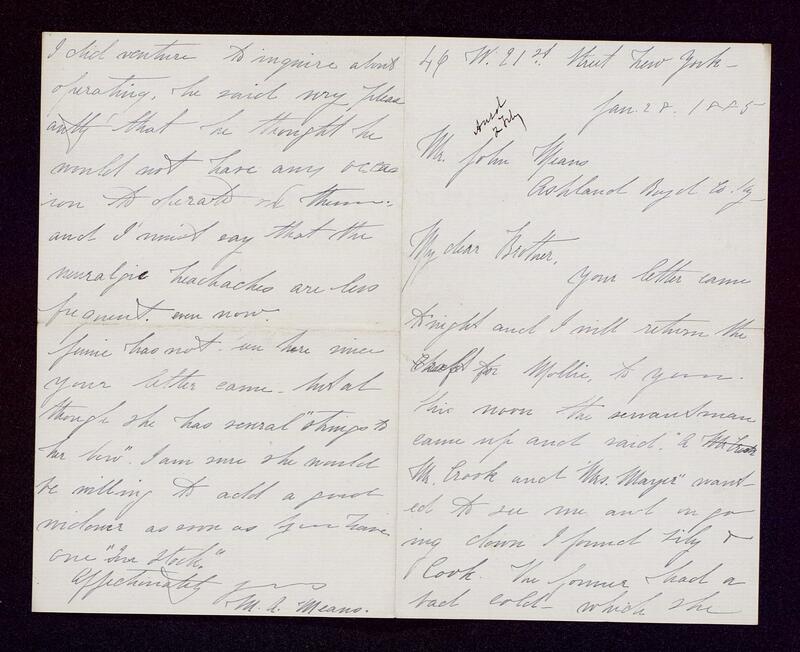 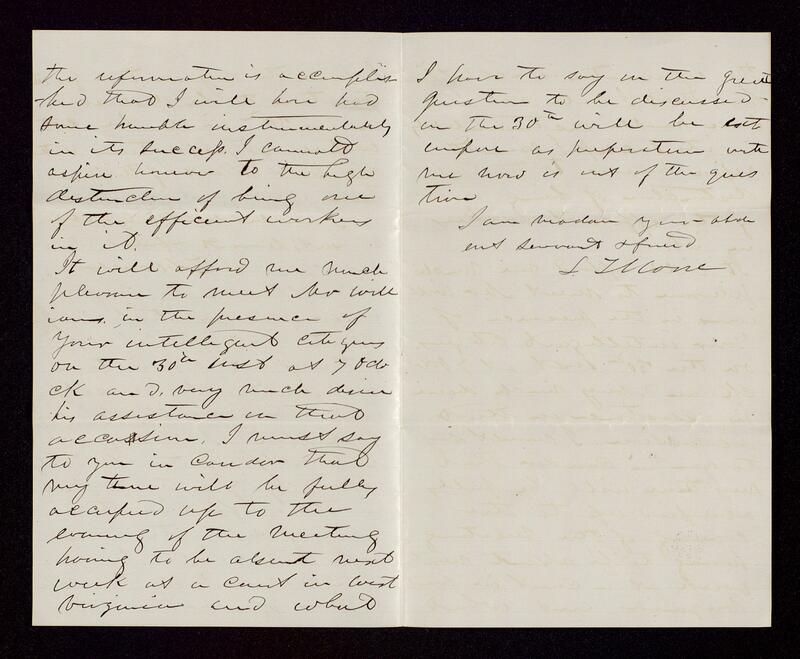 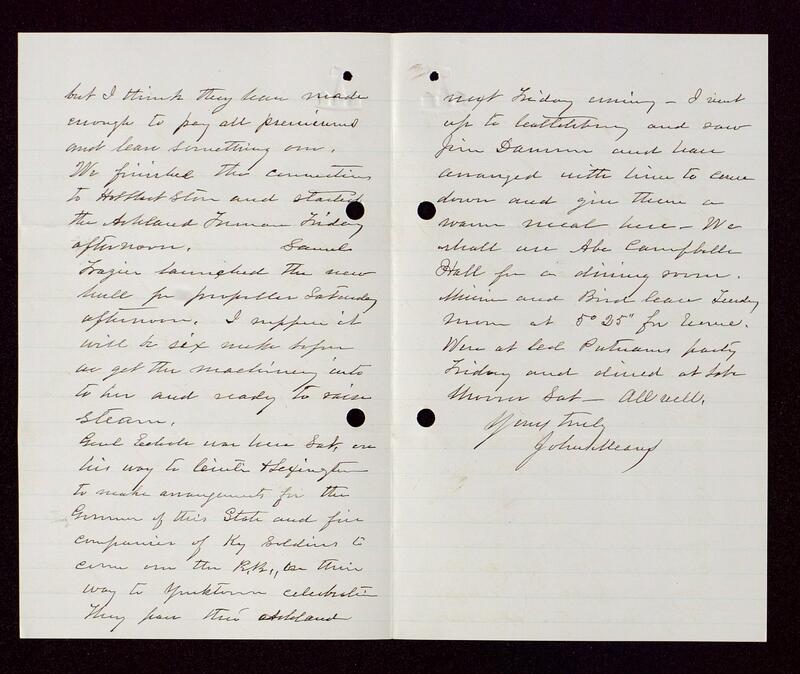 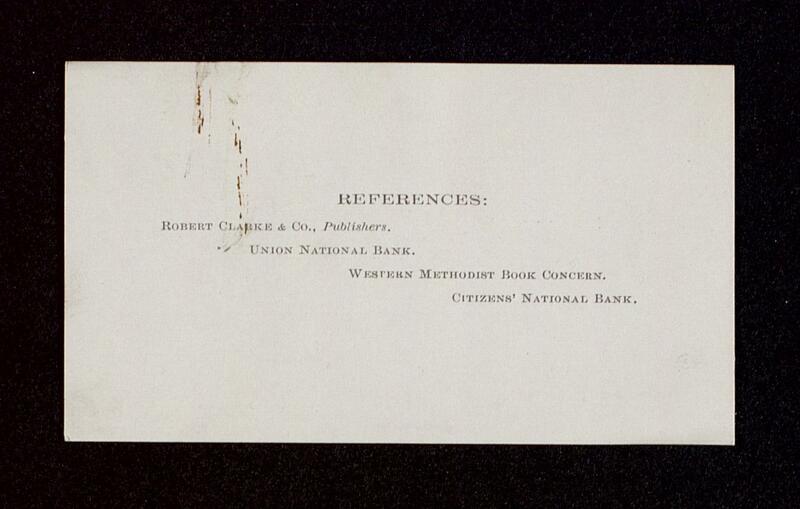 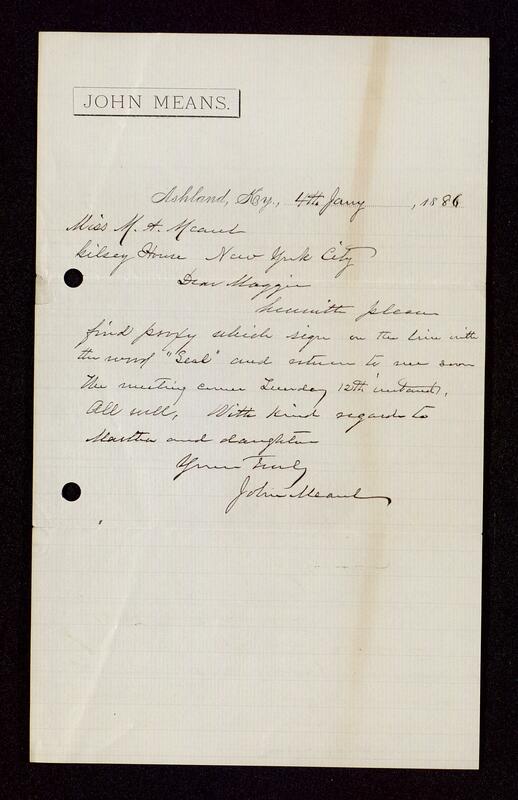 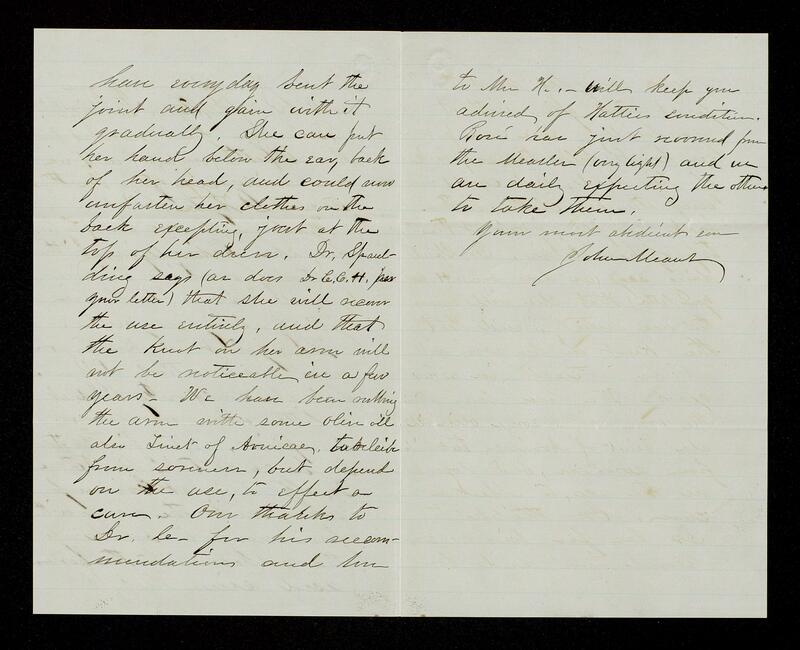 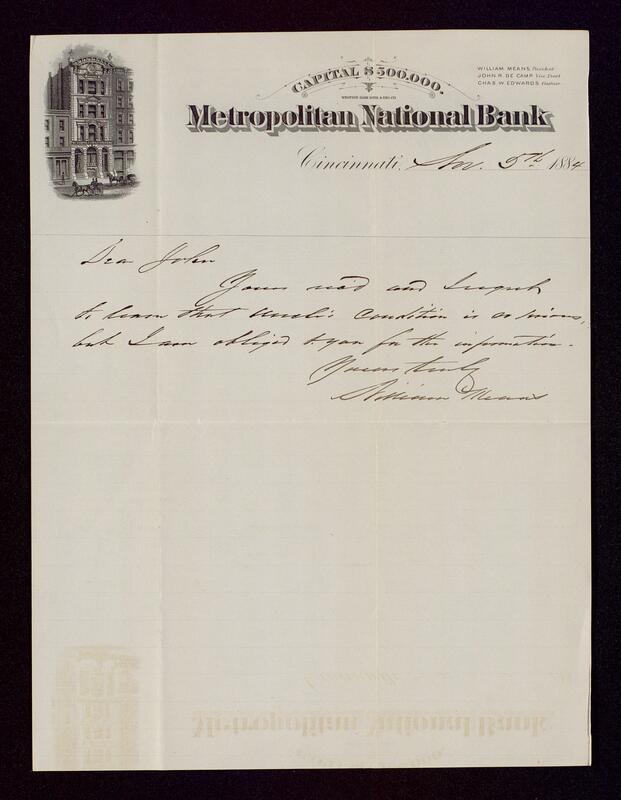 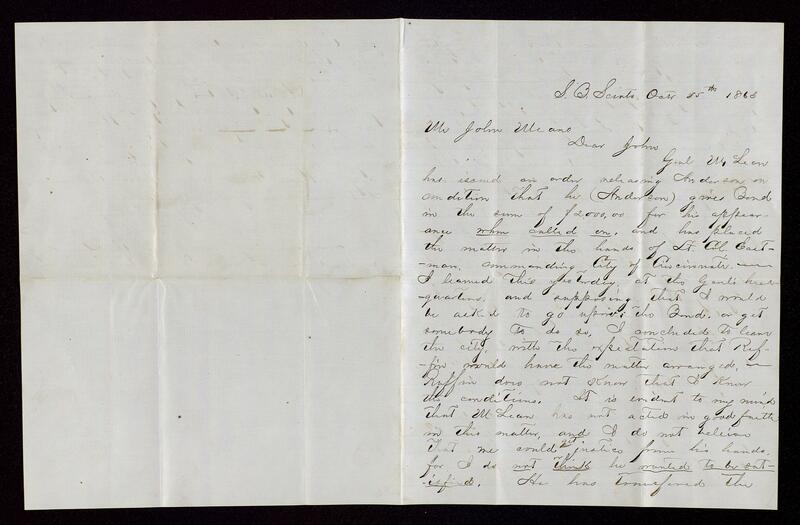 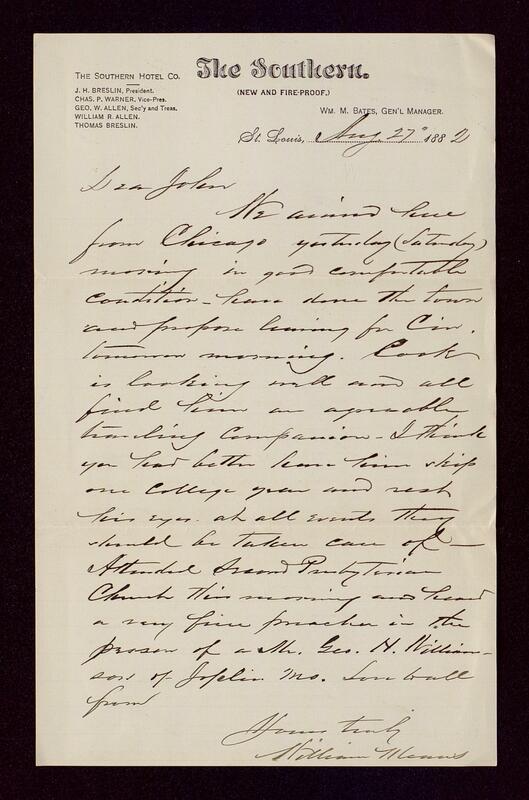 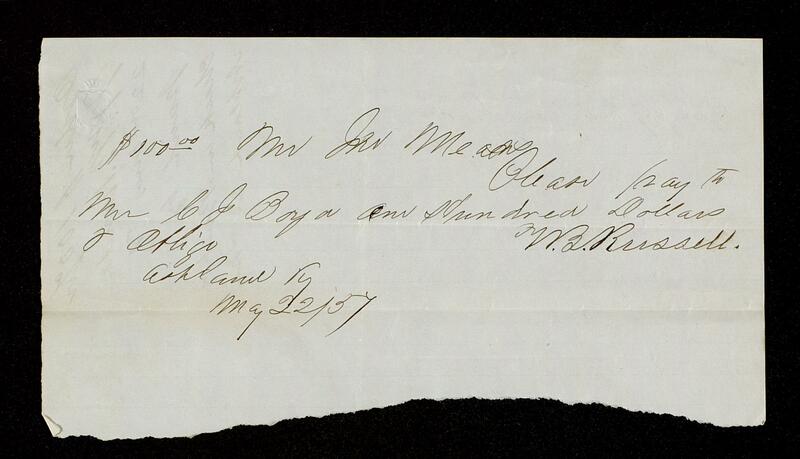 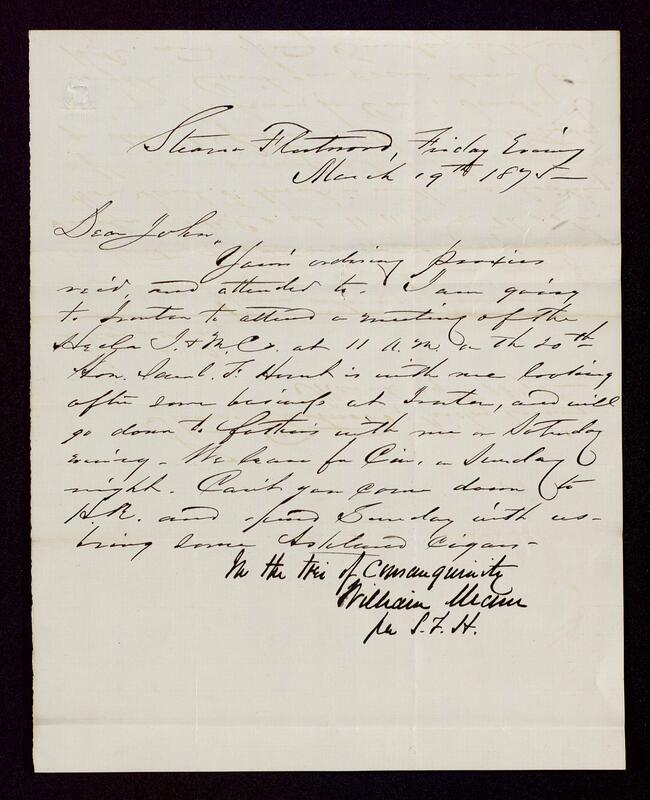 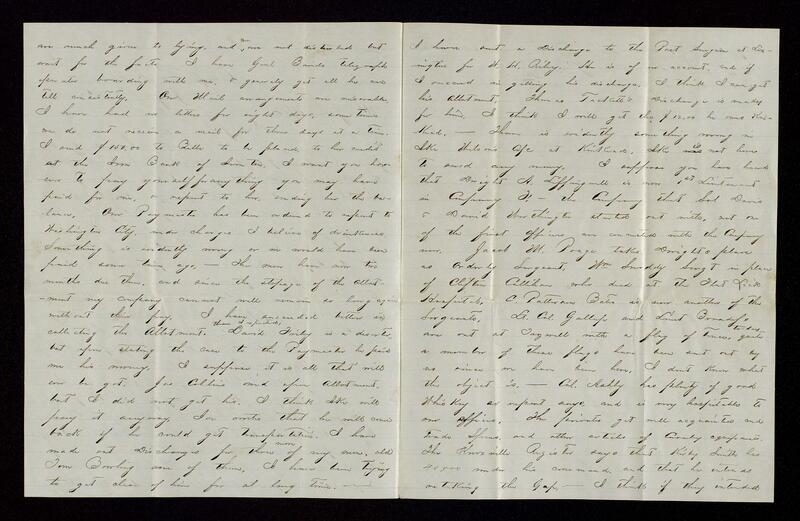 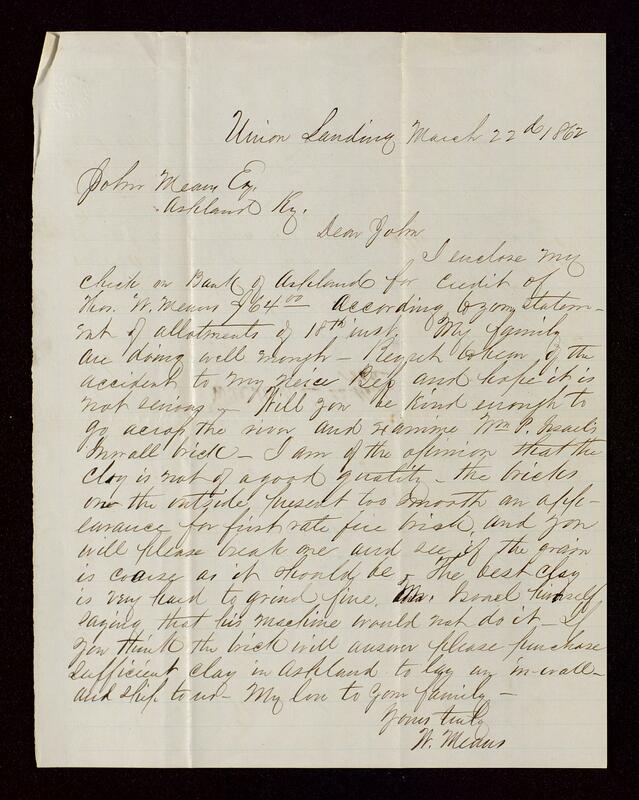 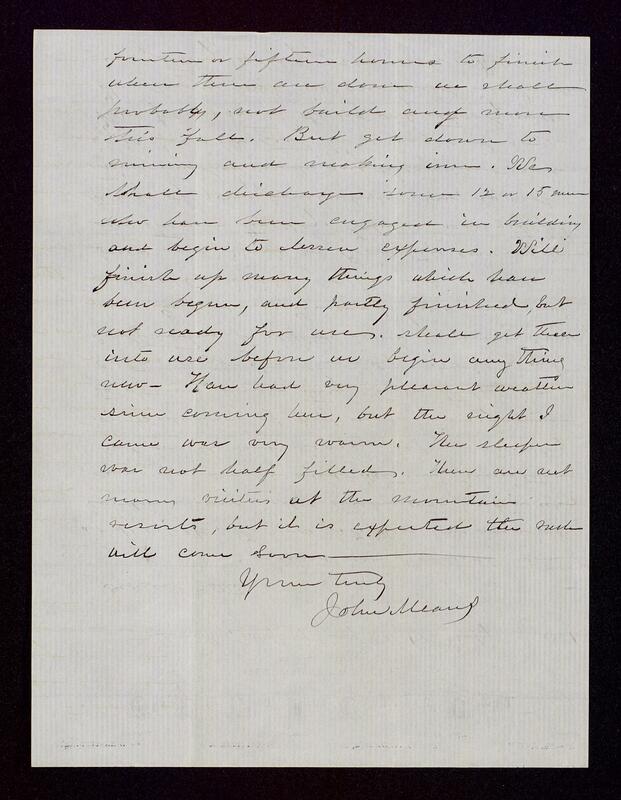 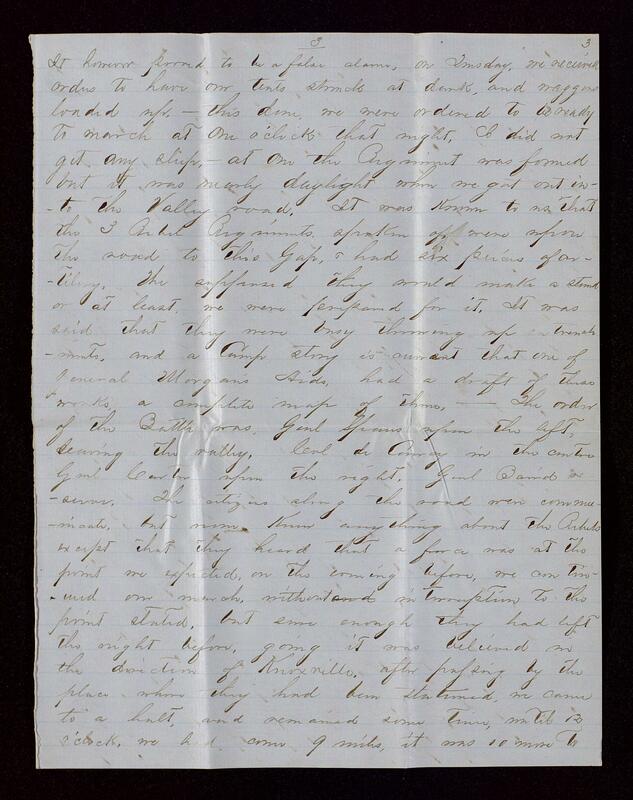 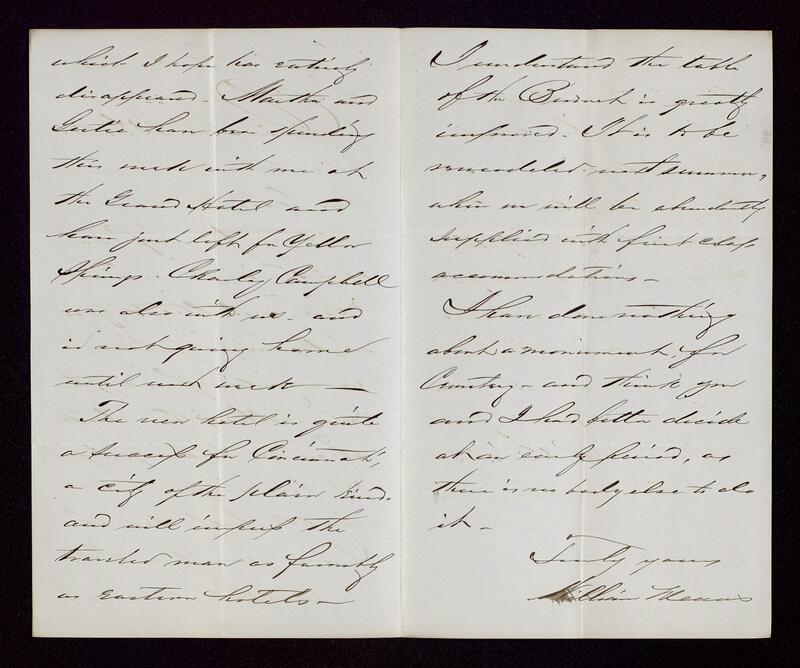 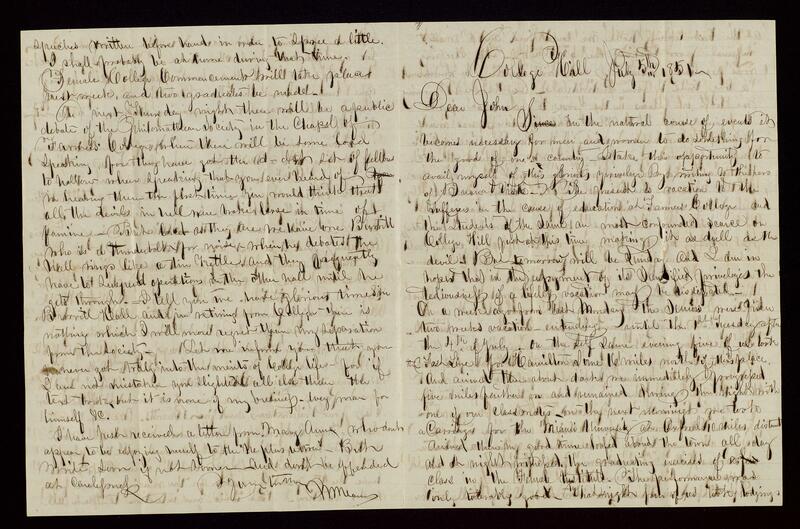 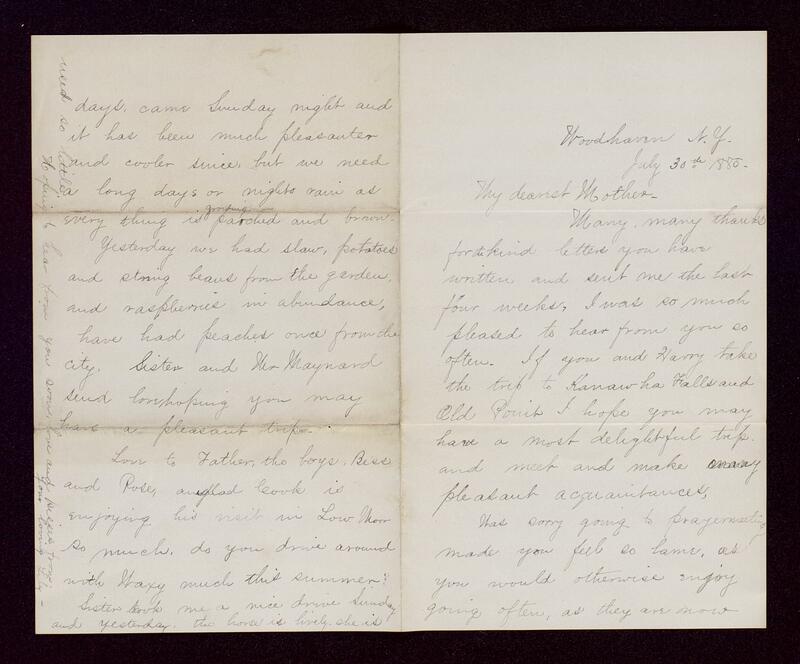 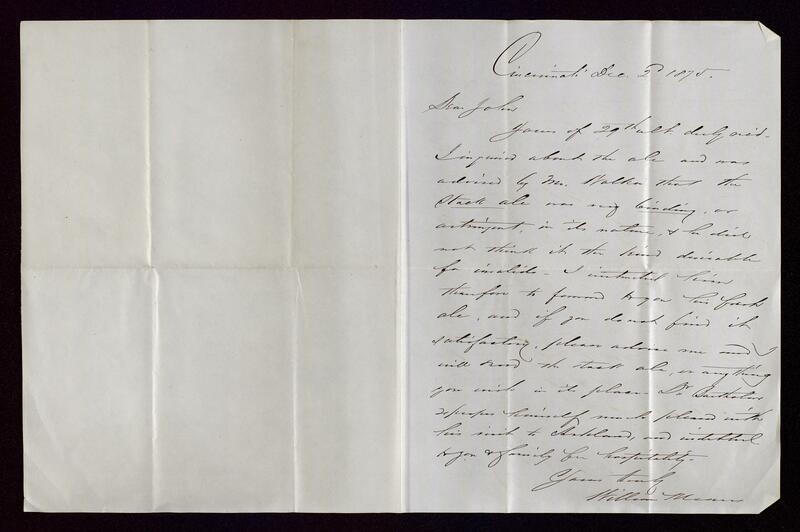 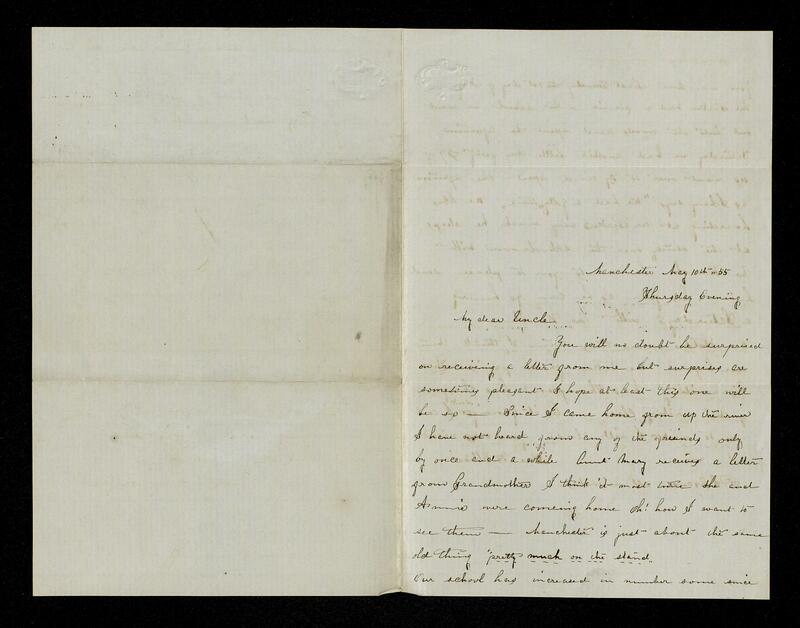 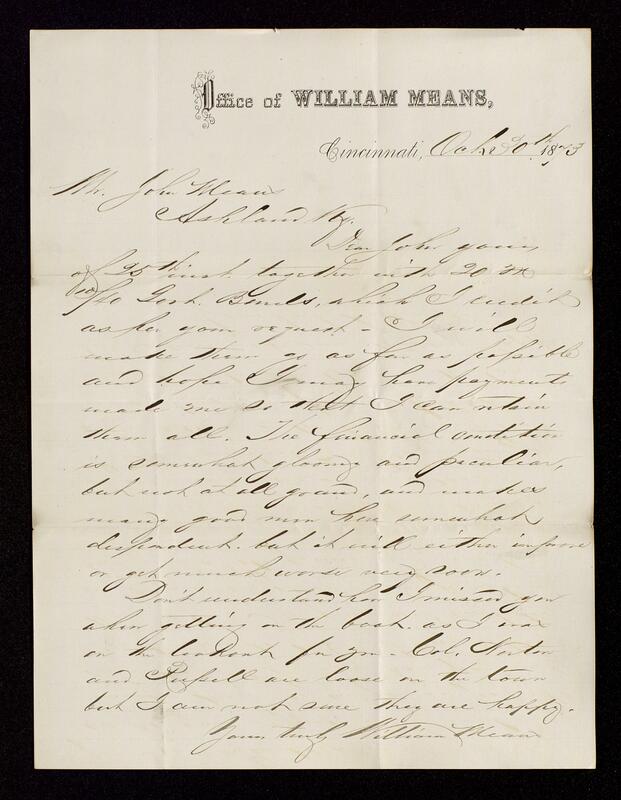 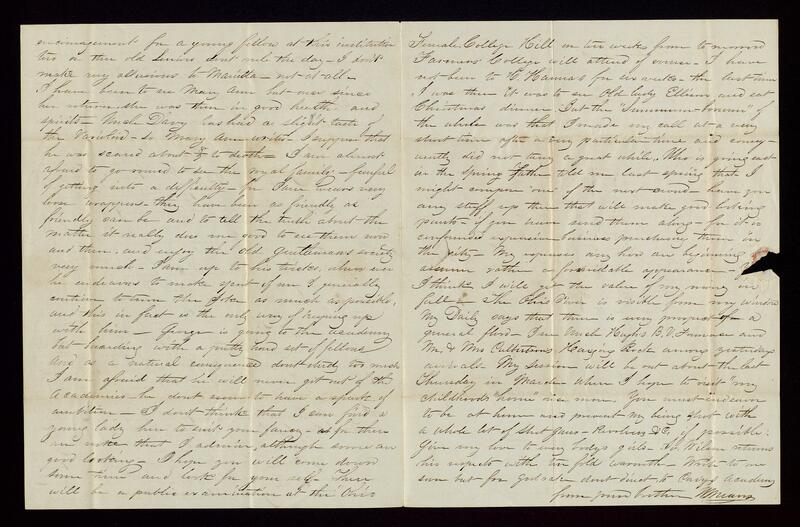 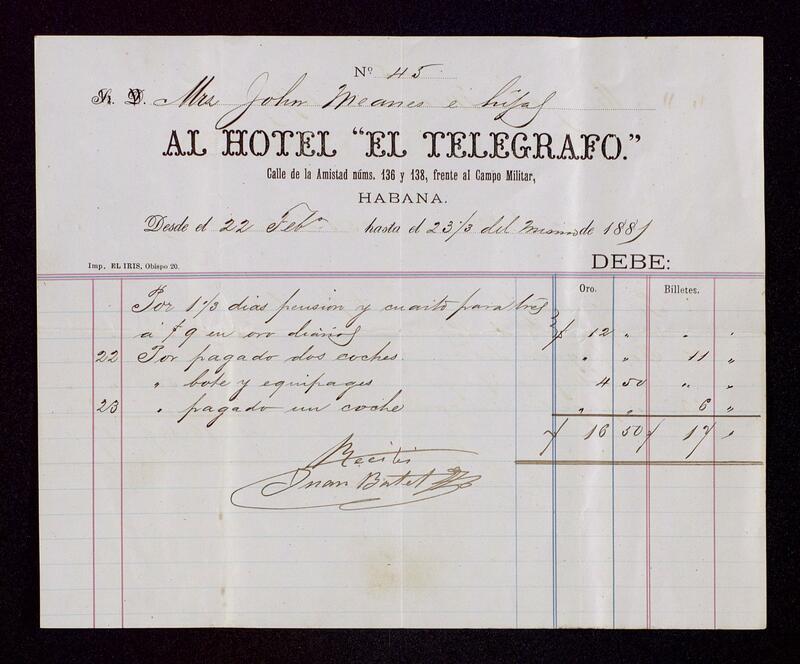 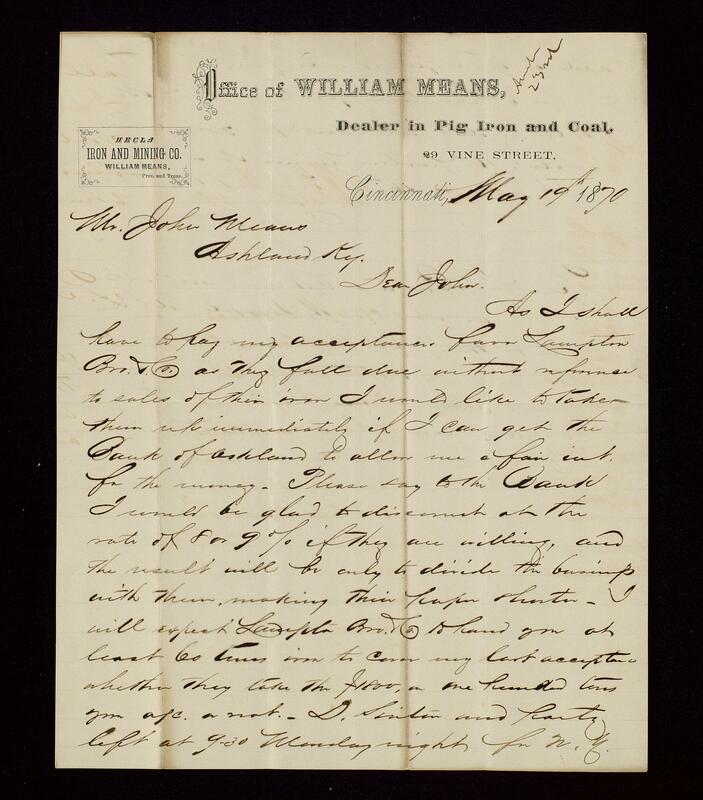 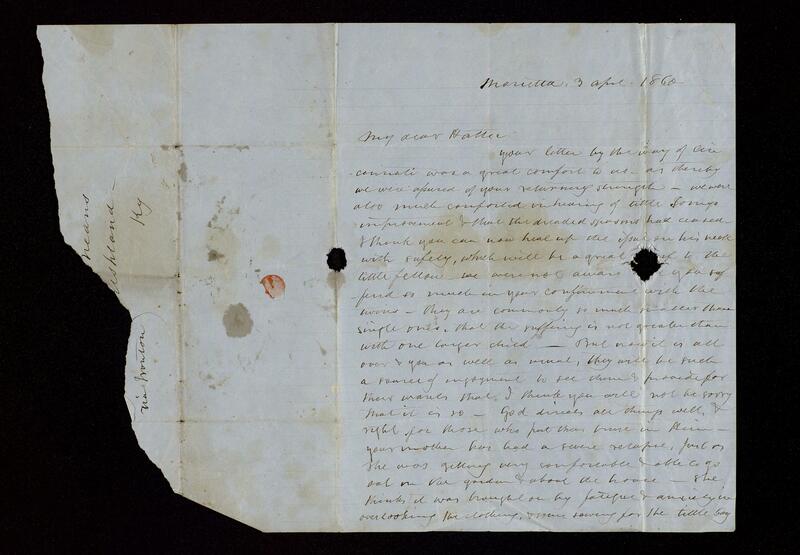 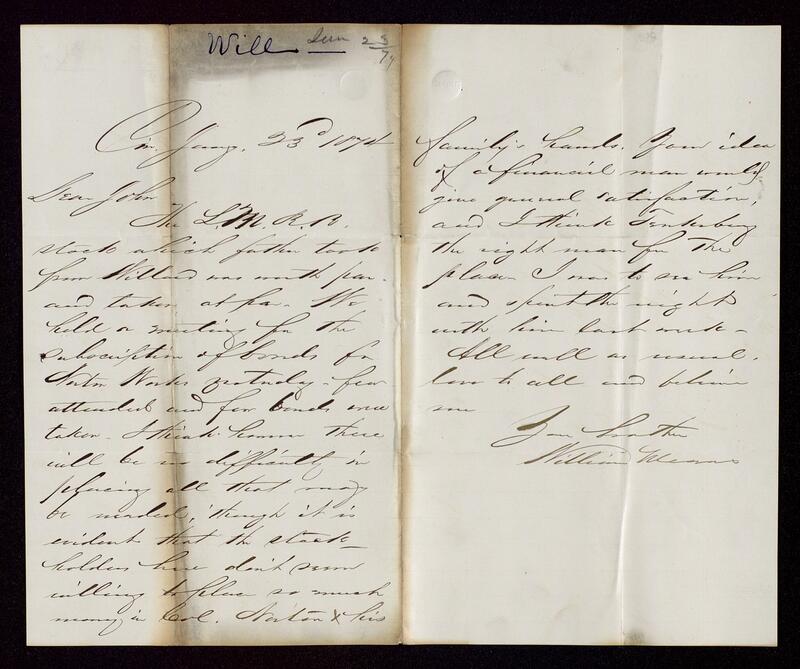 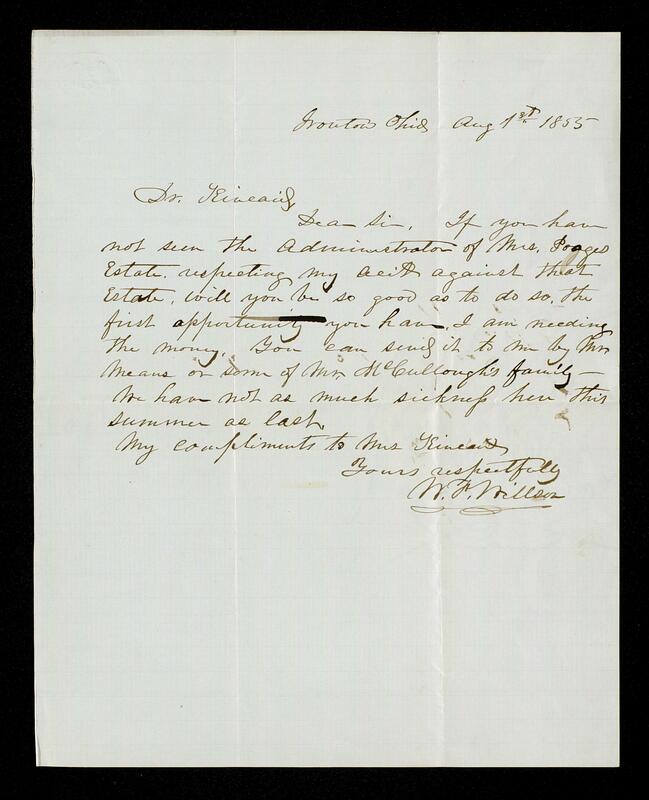 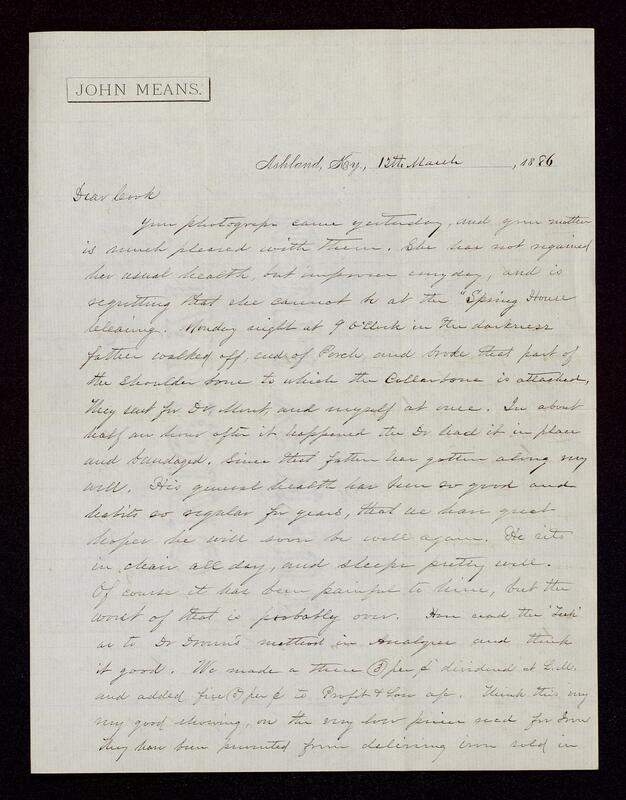 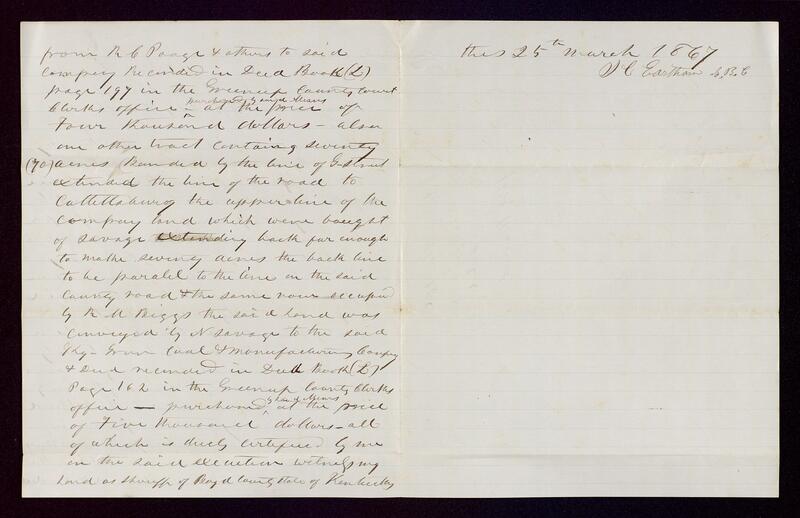 There is both business and personal correspondence from William Means, John Means' brother, who was a bank president and whose letters comment on the effects of the Panic of 1873. 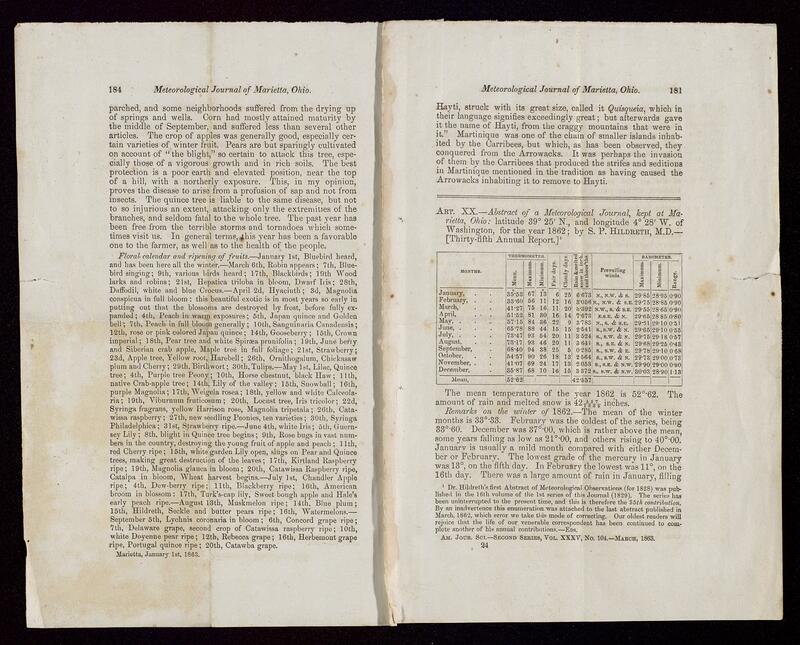 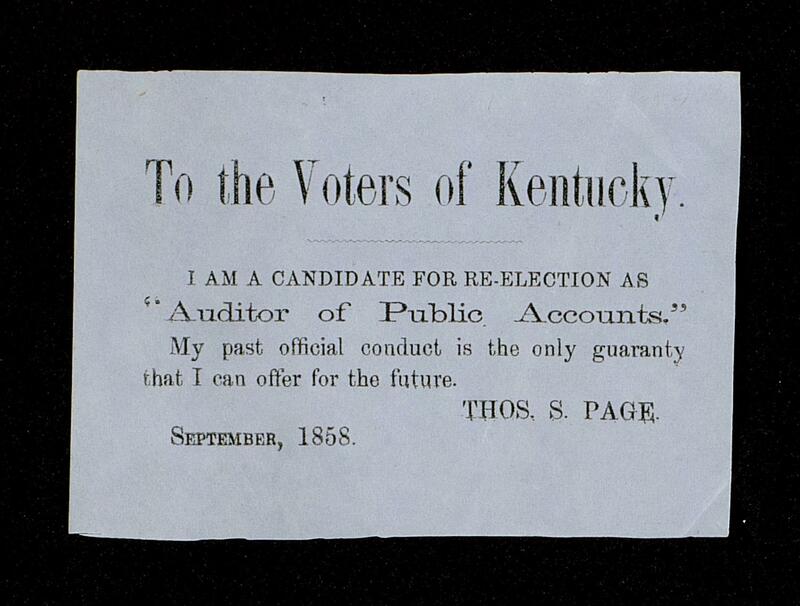 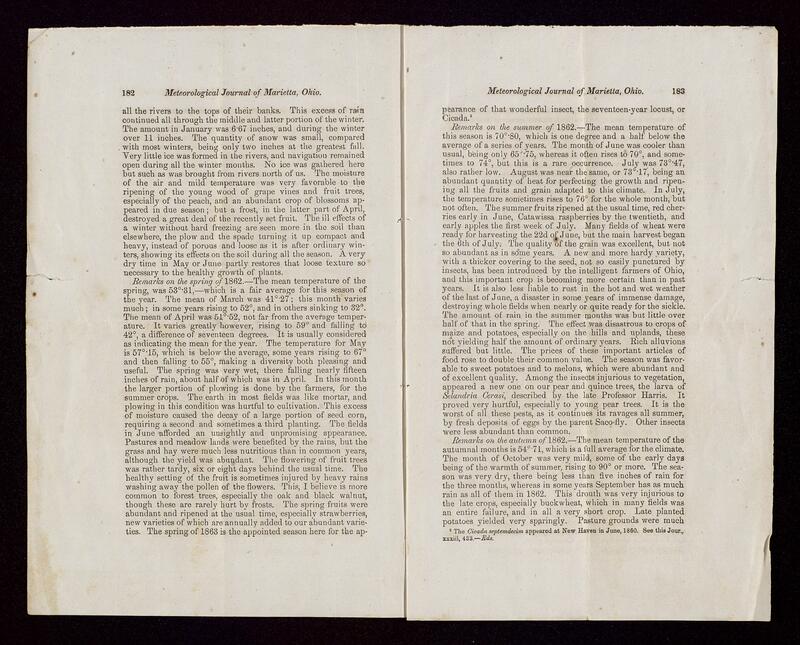 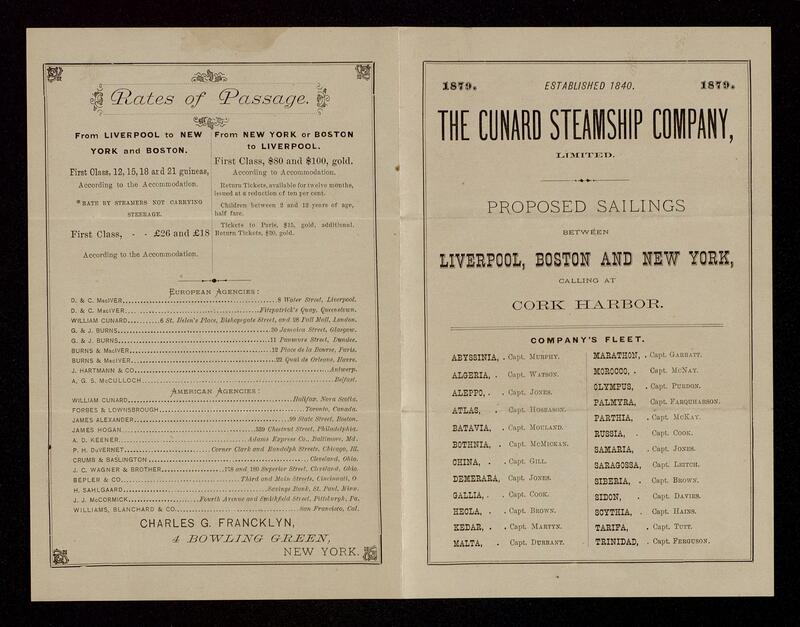 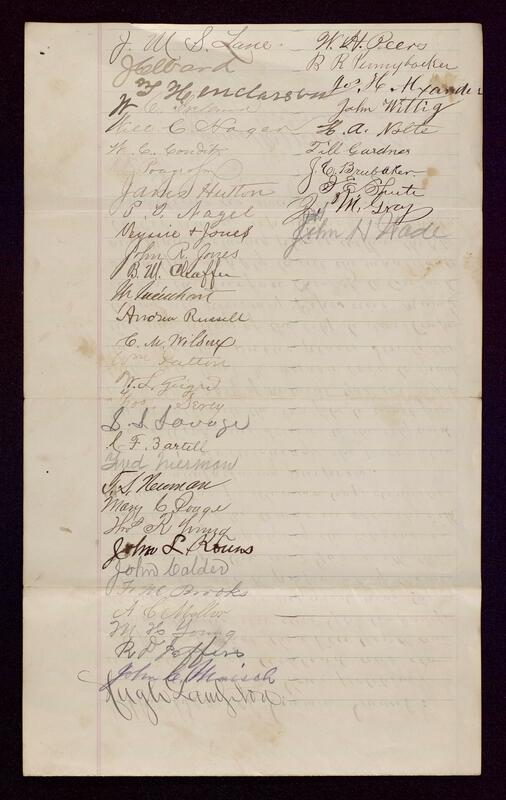 Also included are an offer of the nomination for U.S. Representative from southern Ohio to Thomas W. Means and letters to John Means from John G. Peebles of Portsmouth, advising Means on a campaign for U.S. Representative from eastern Kentucky. 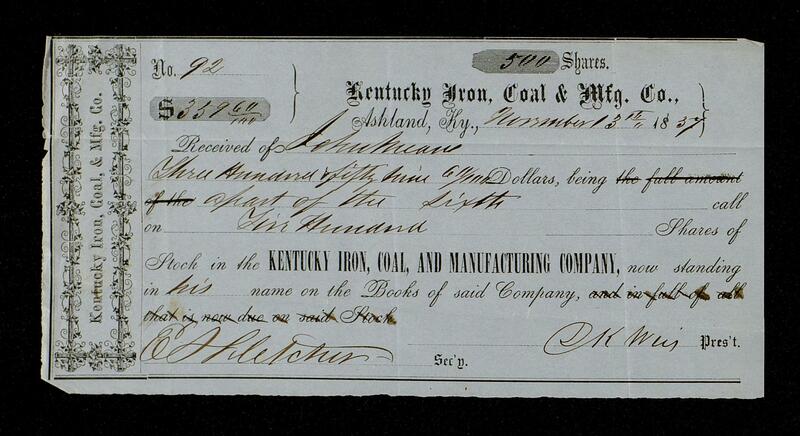 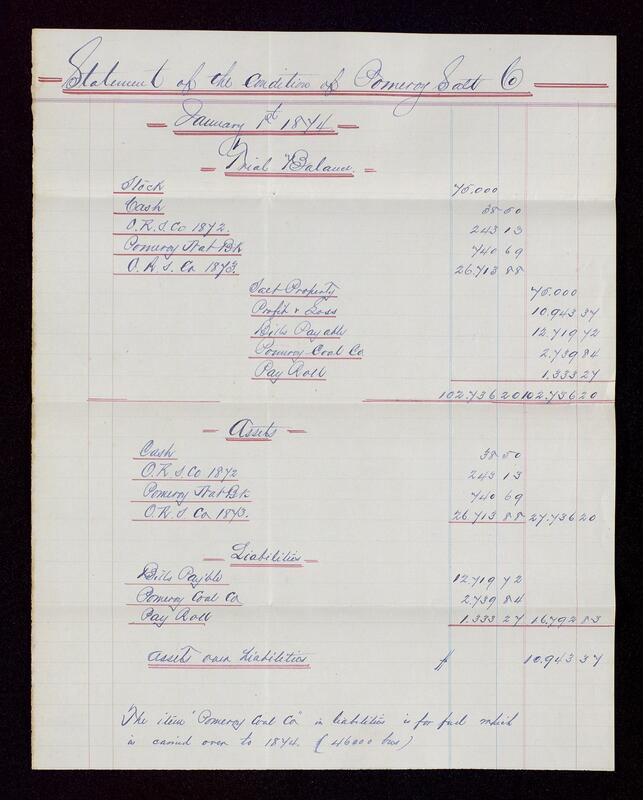 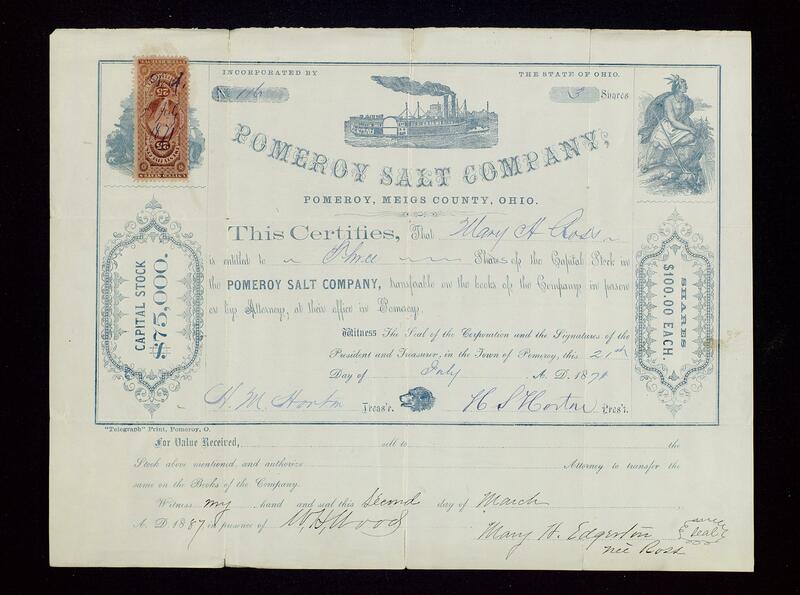 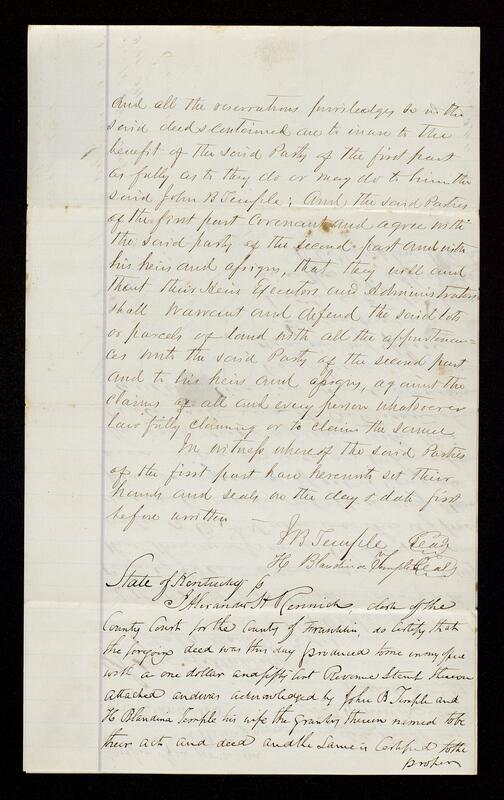 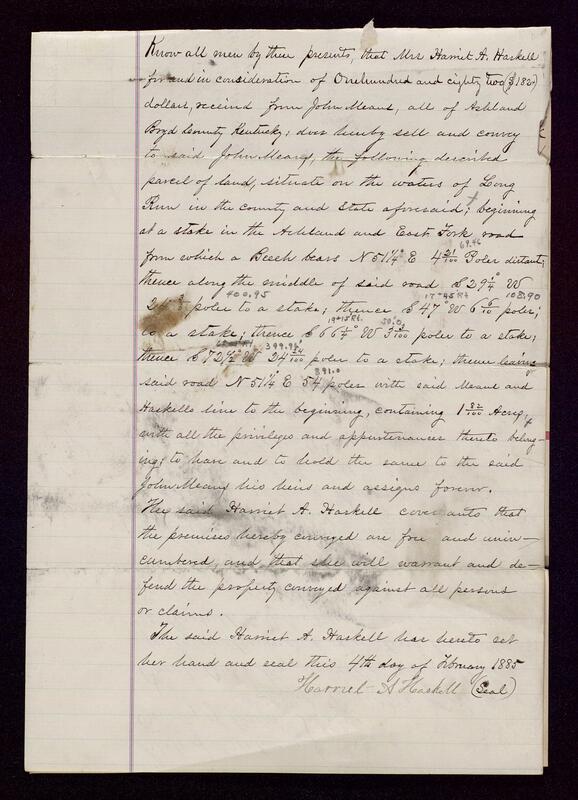 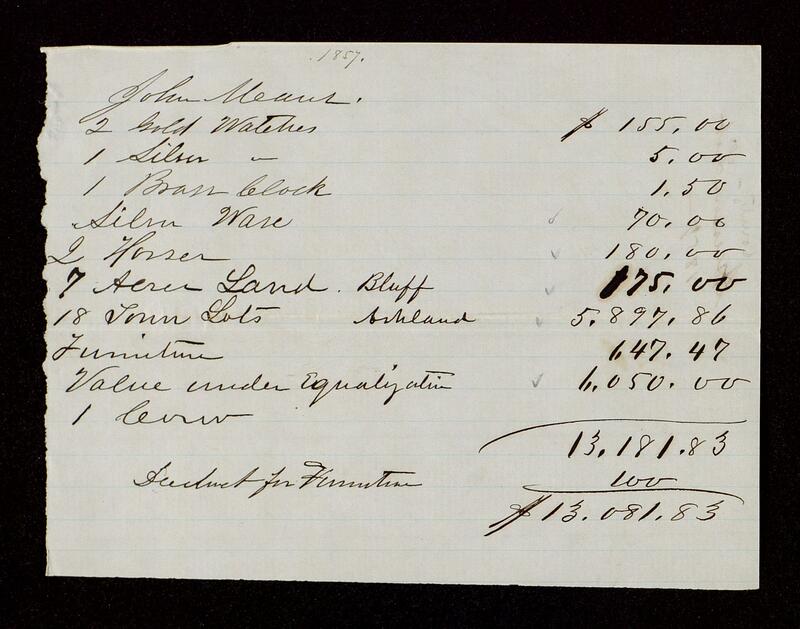 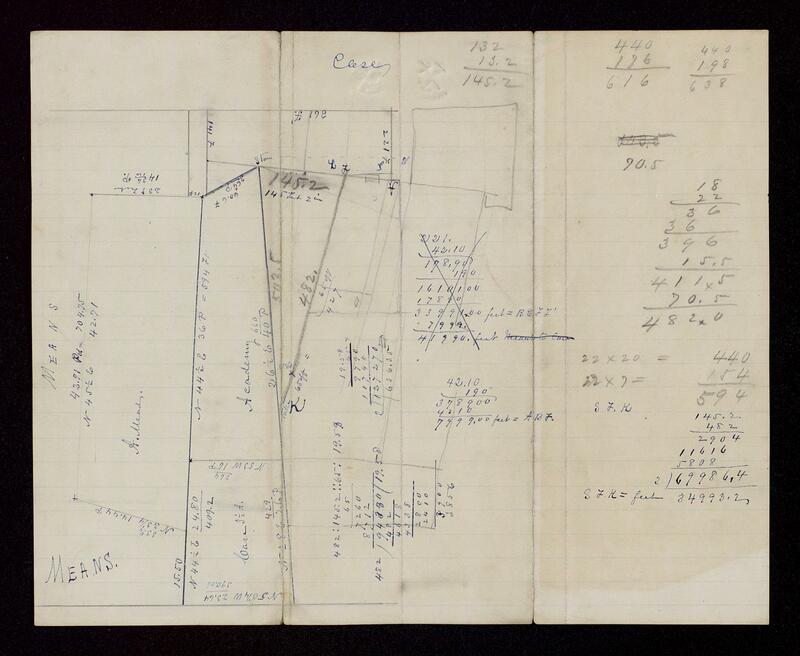 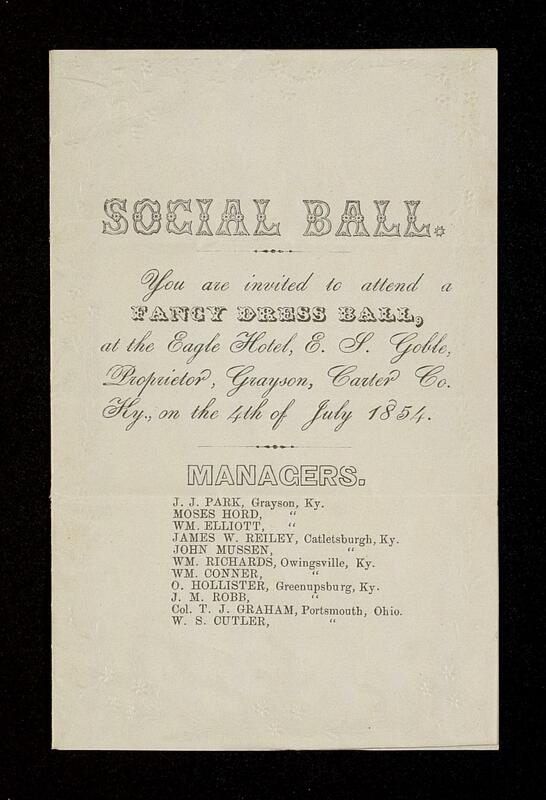 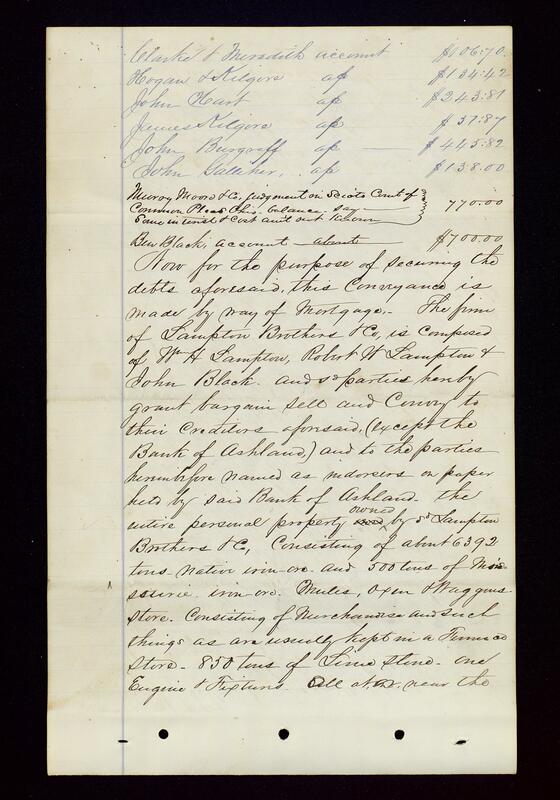 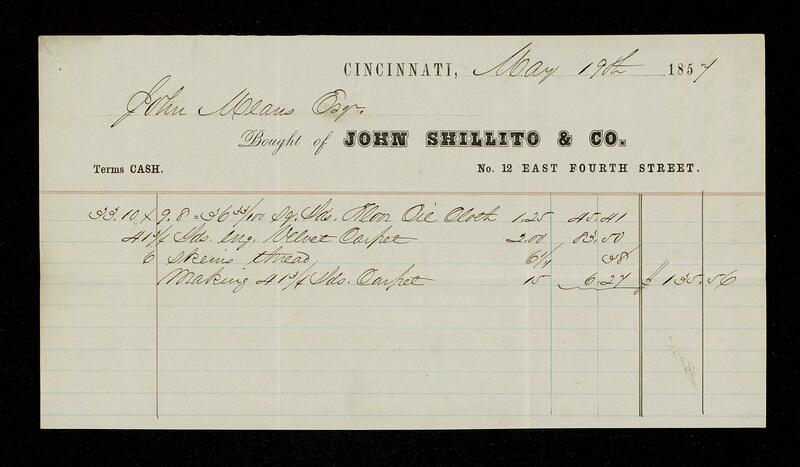 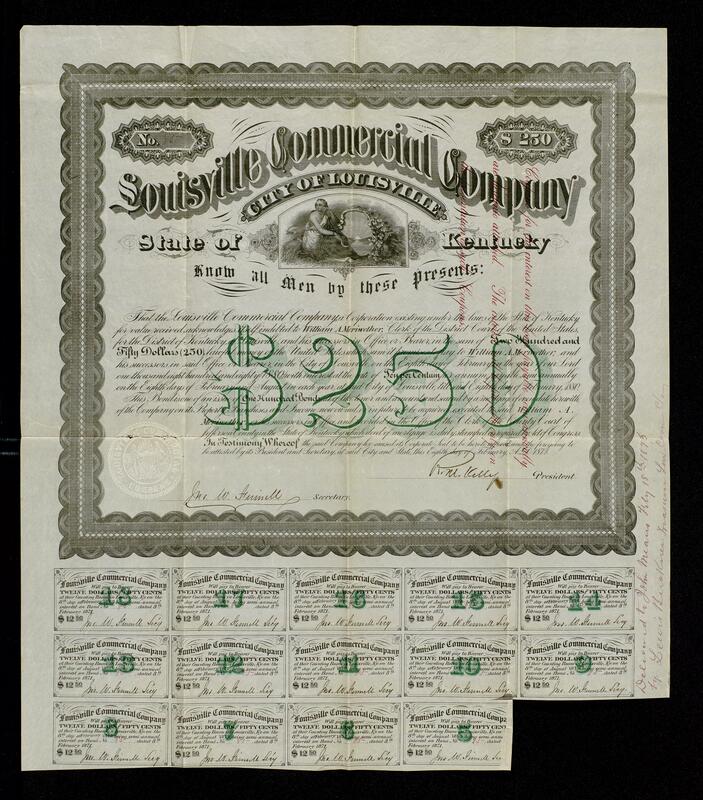 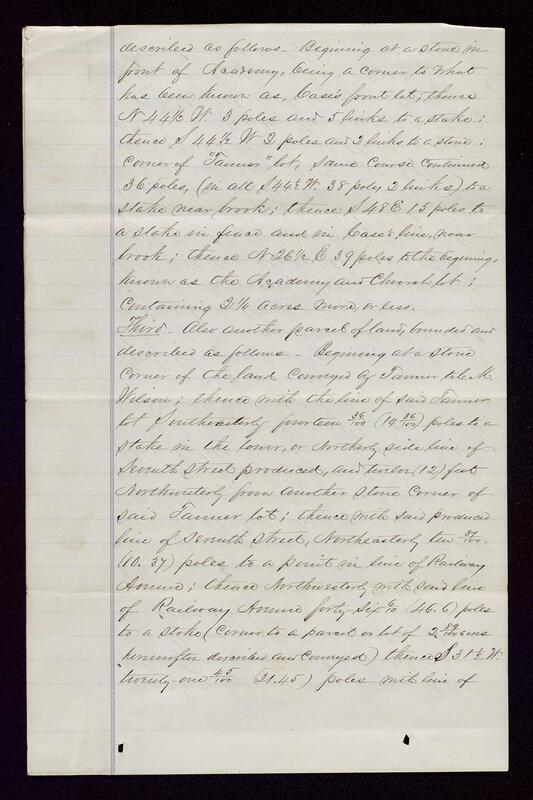 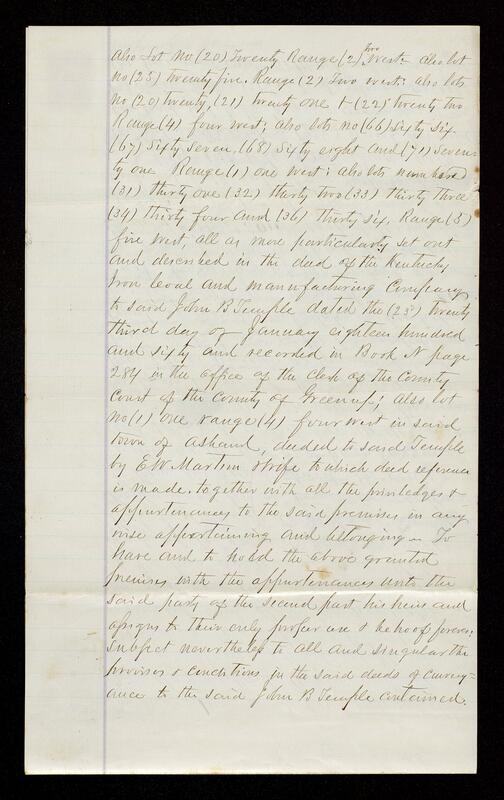 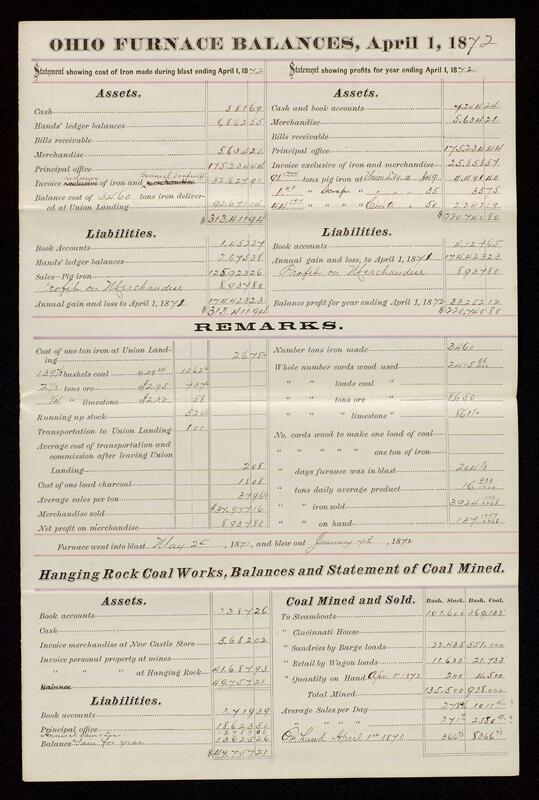 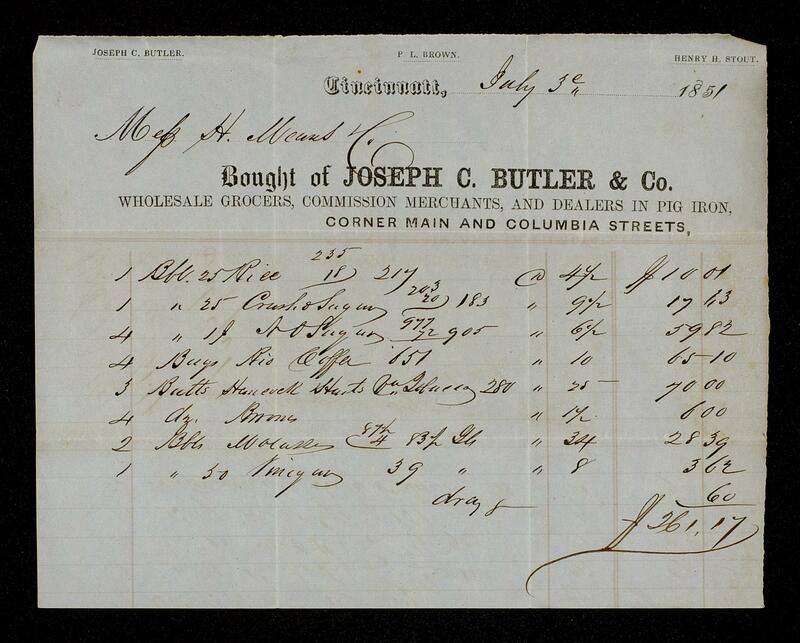 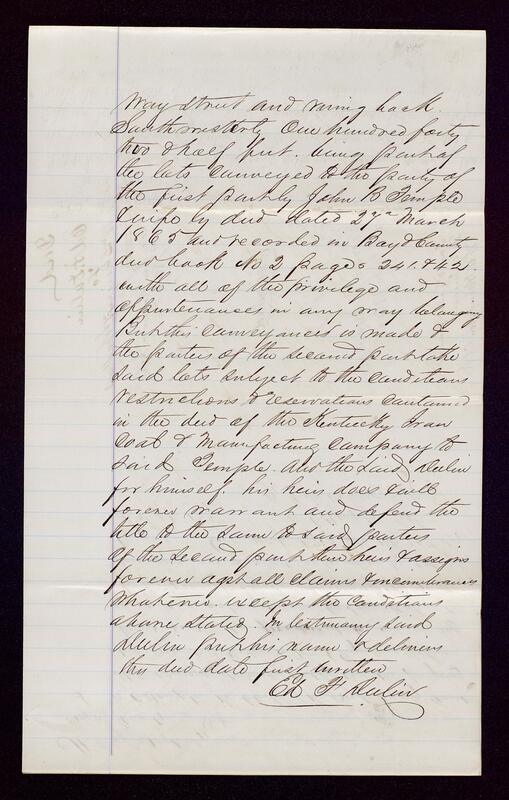 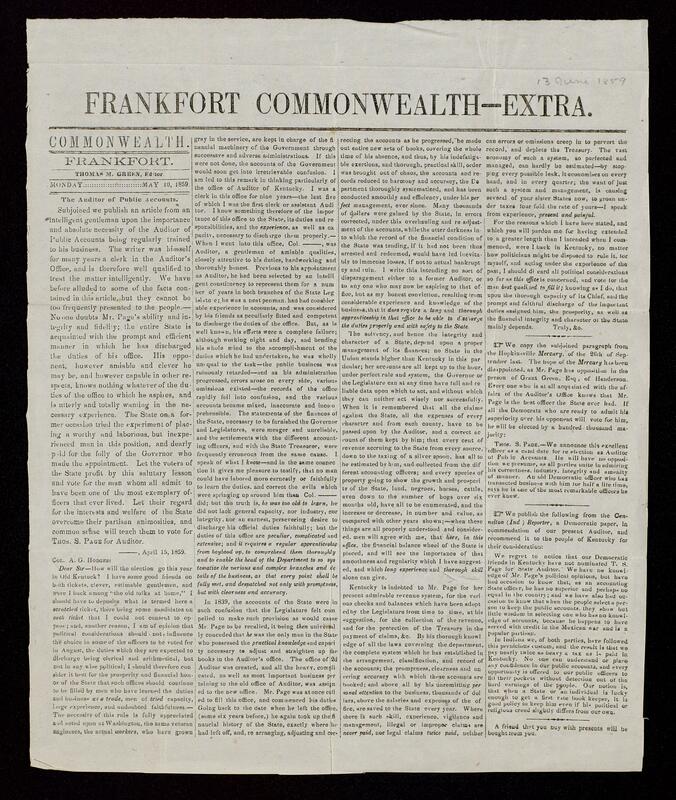 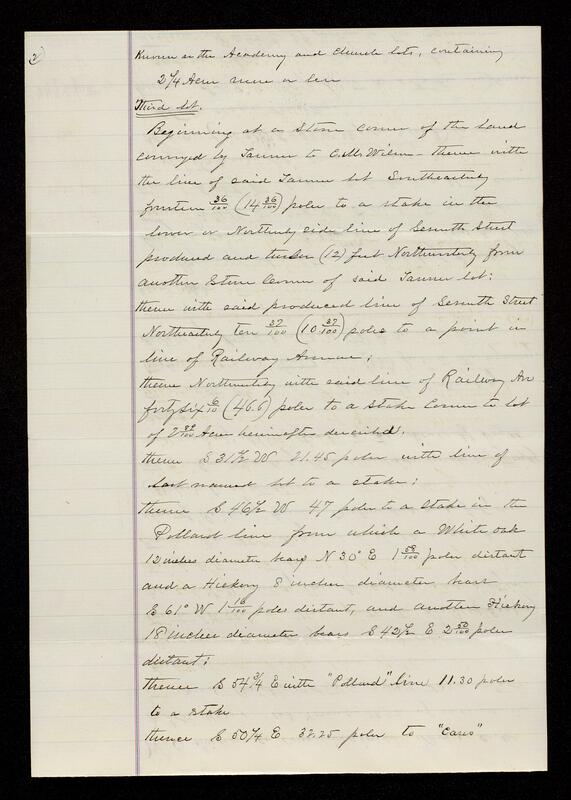 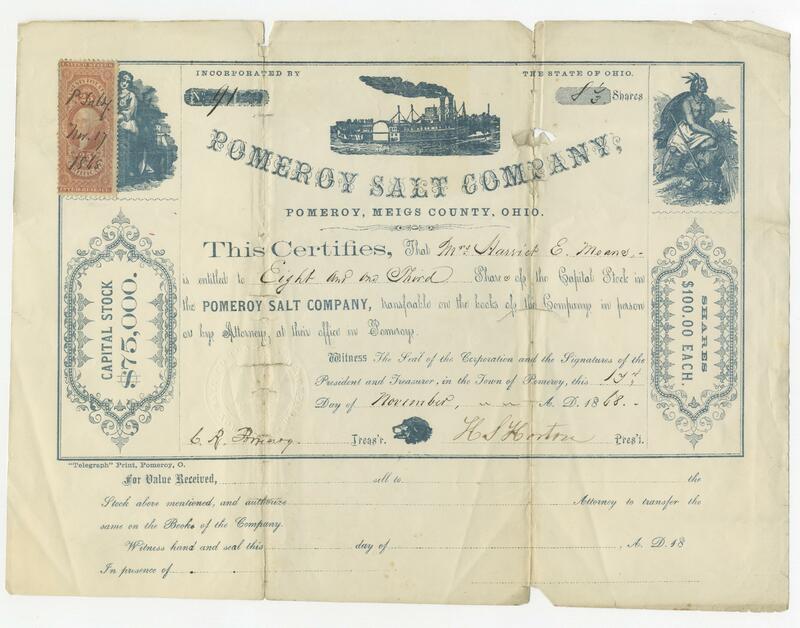 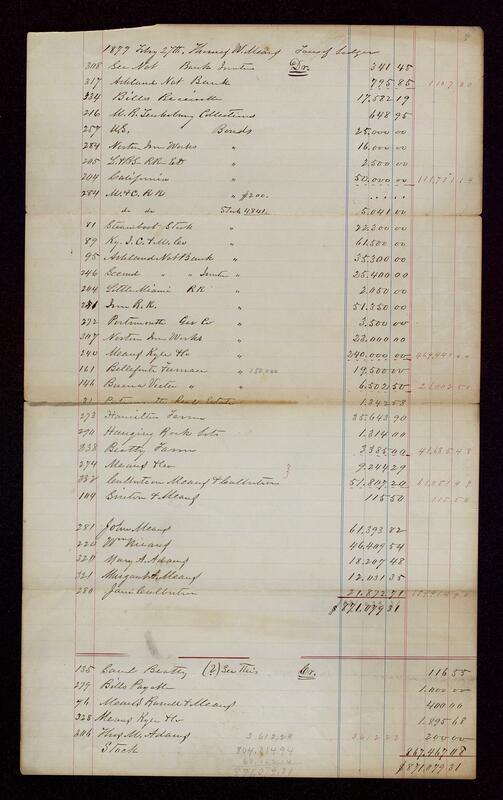 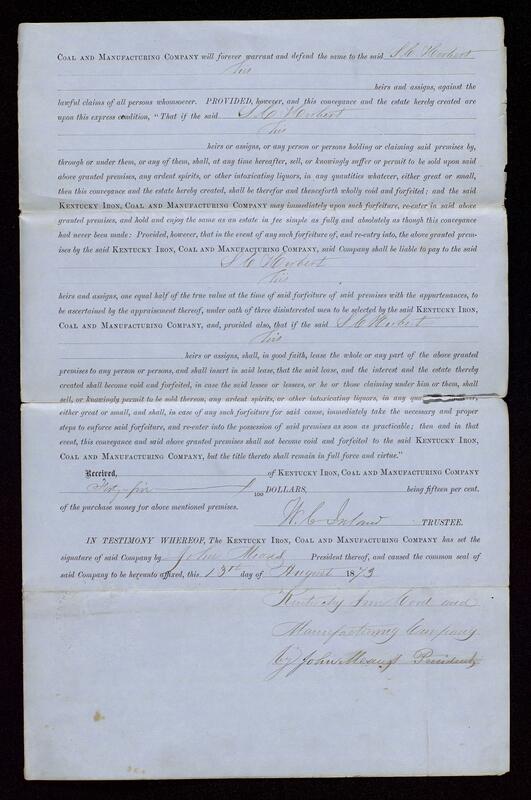 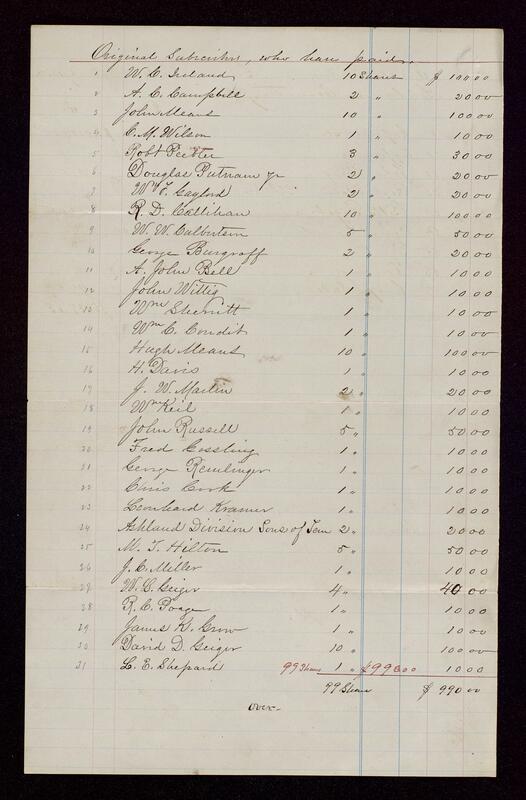 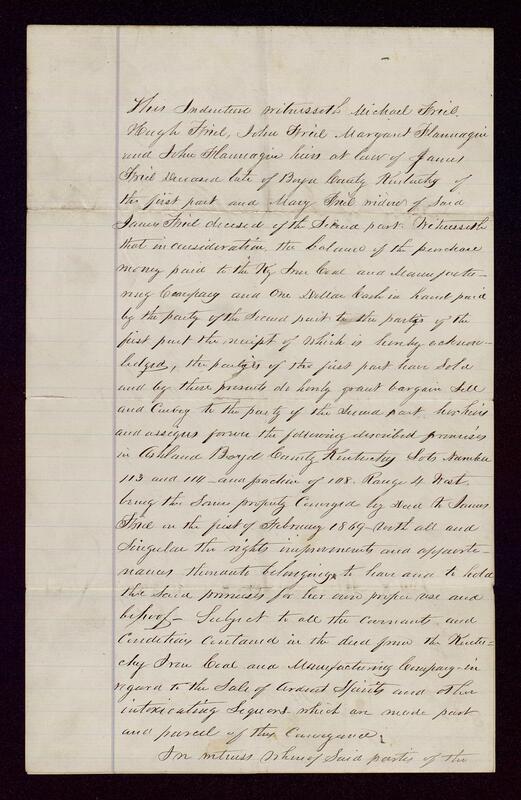 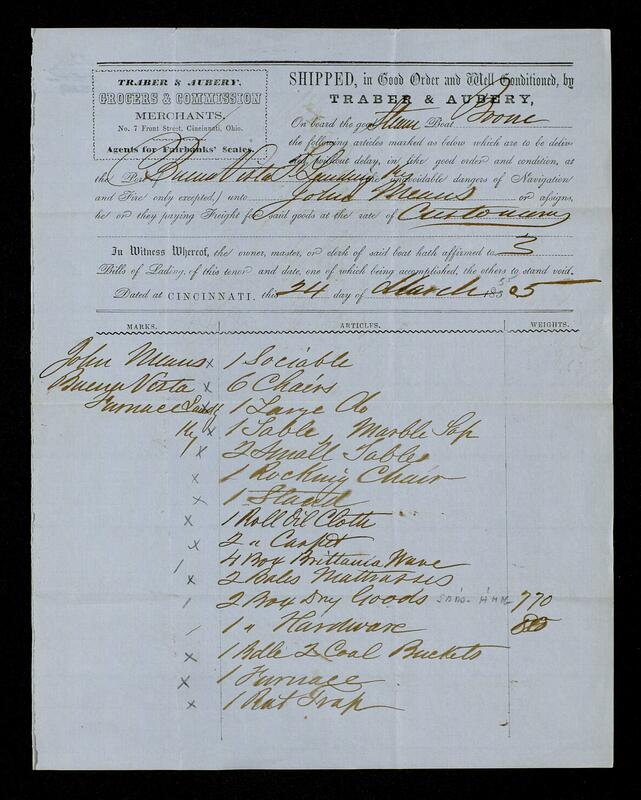 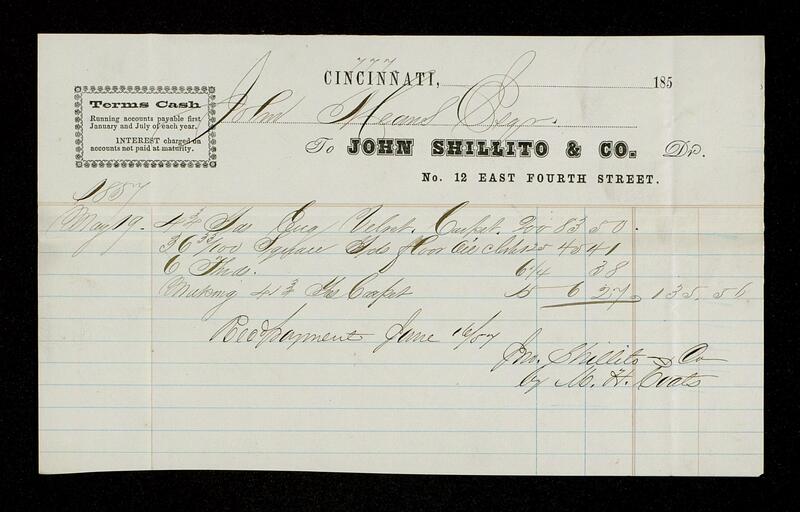 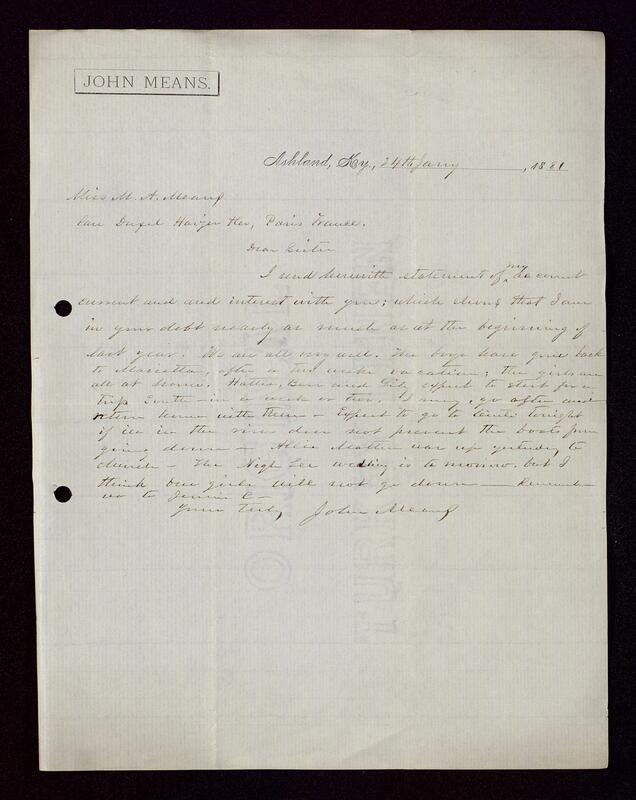 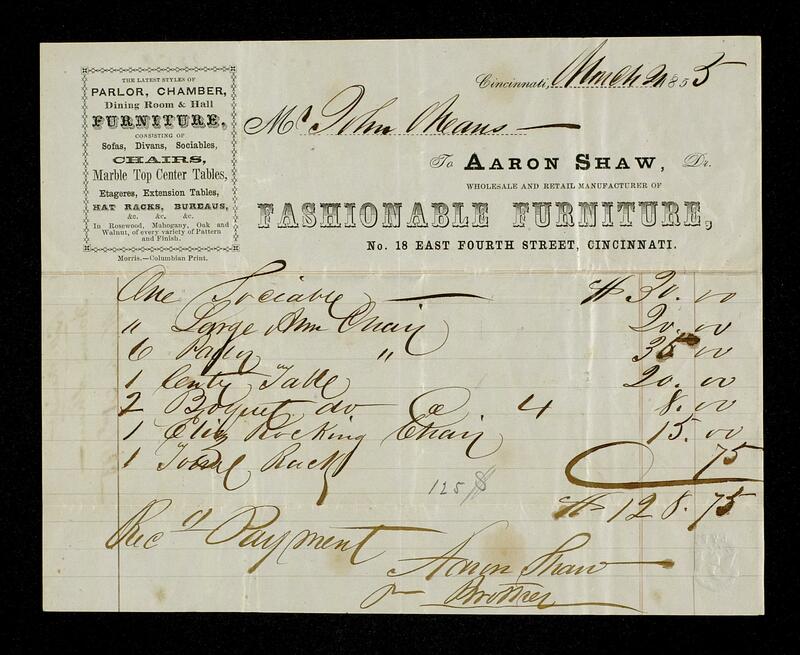 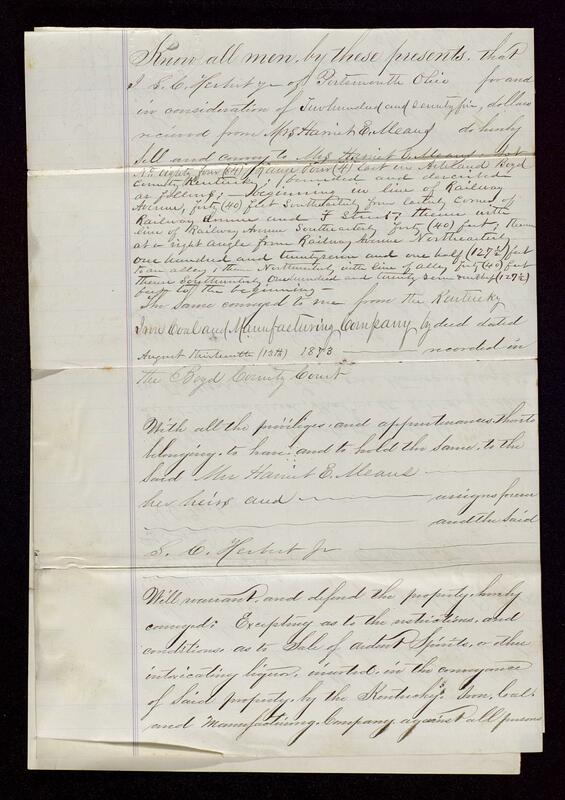 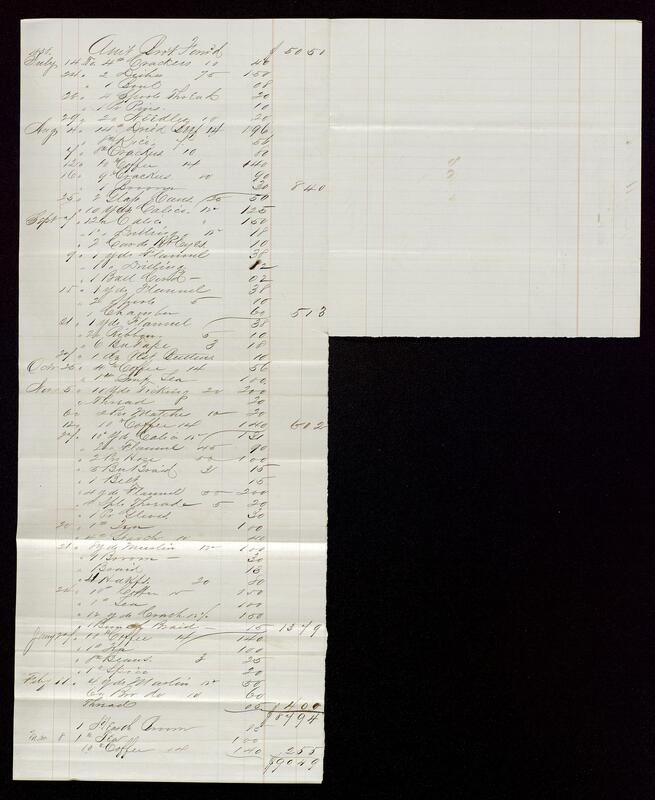 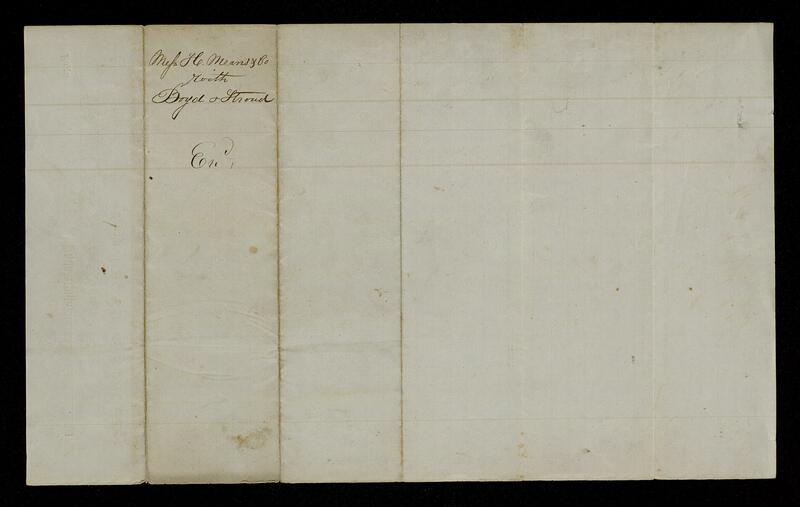 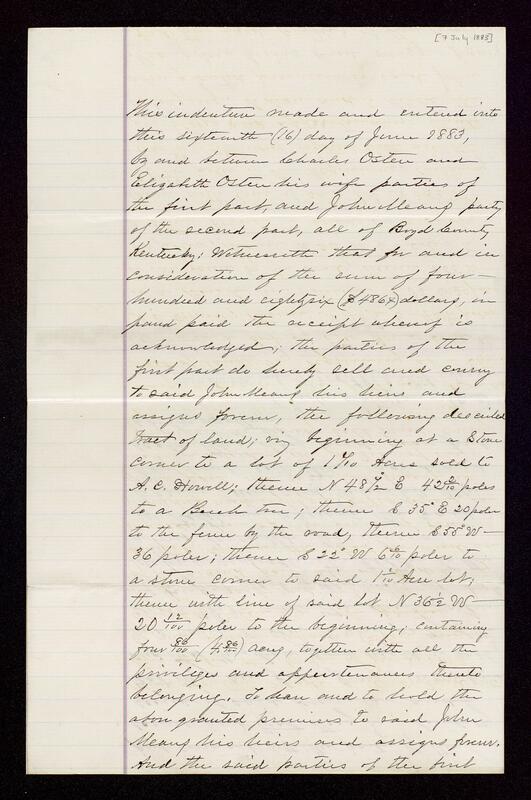 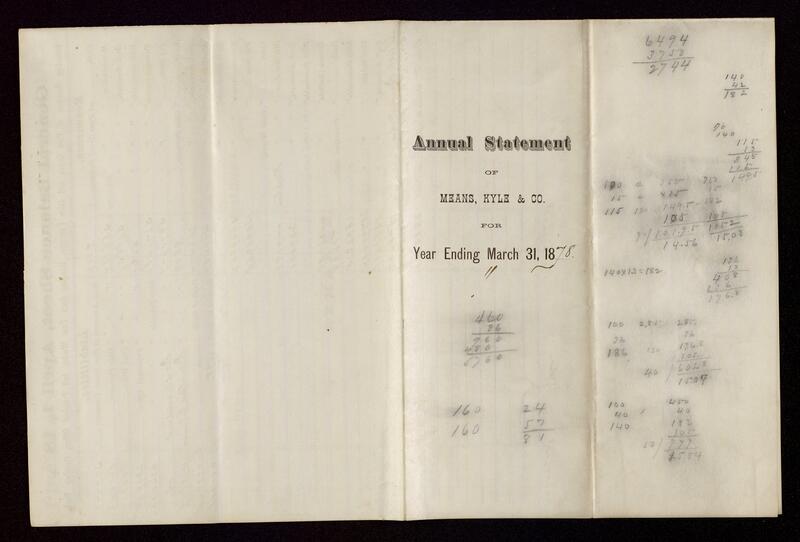 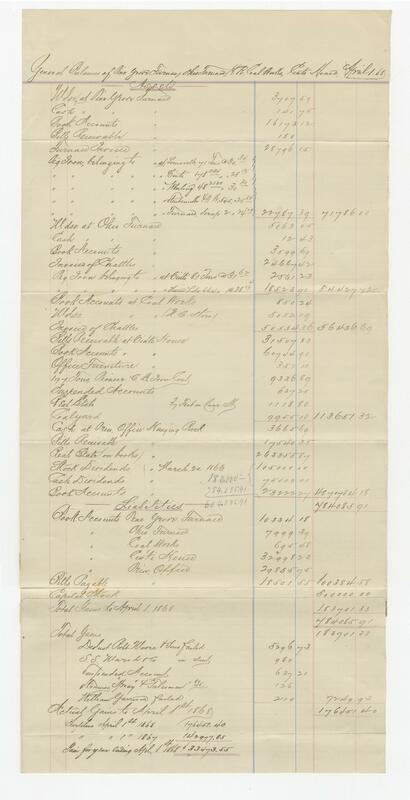 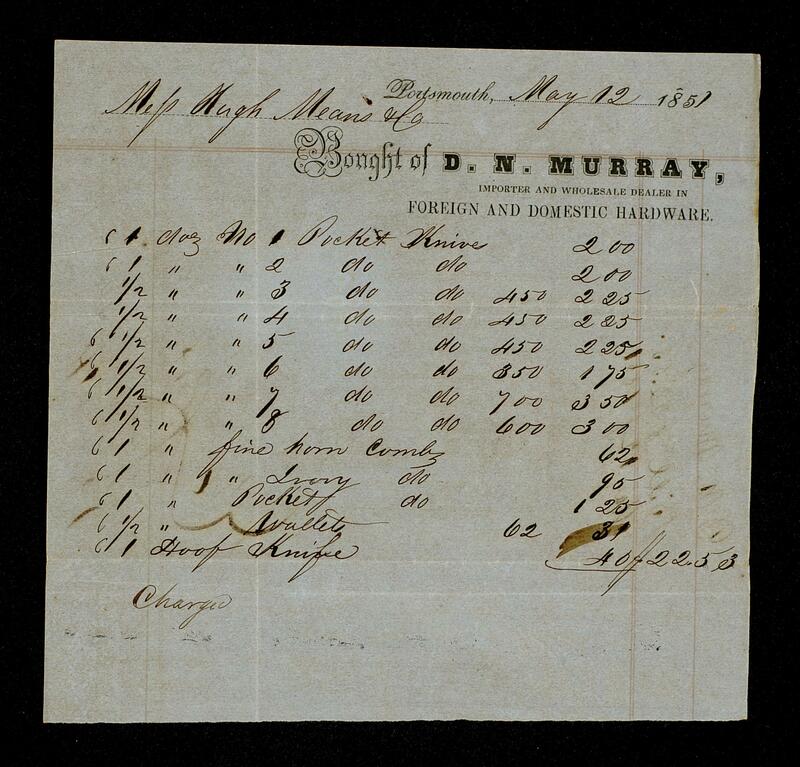 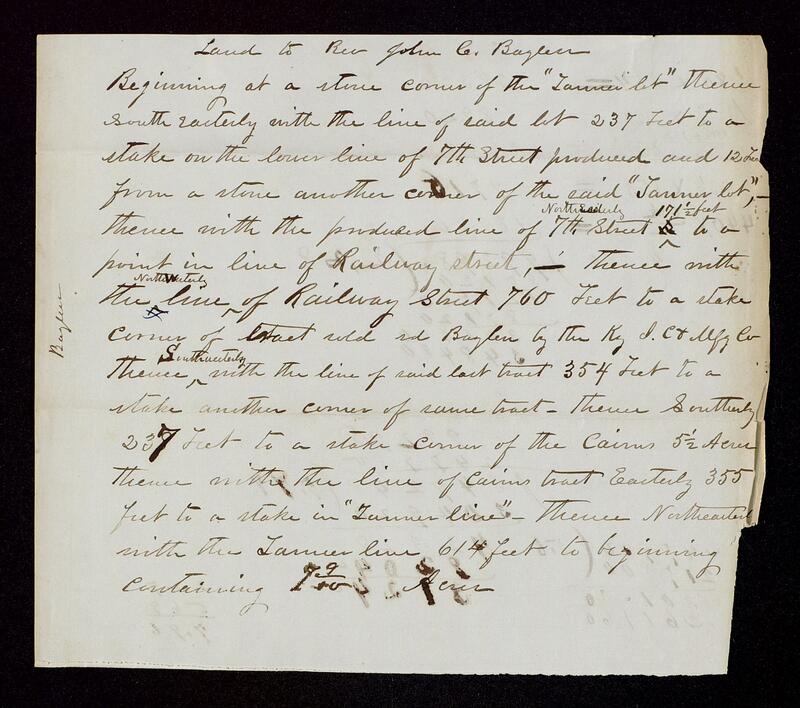 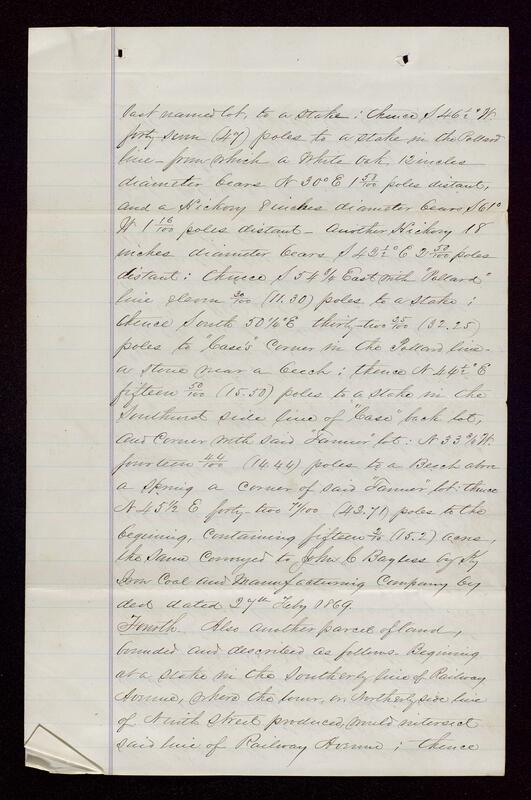 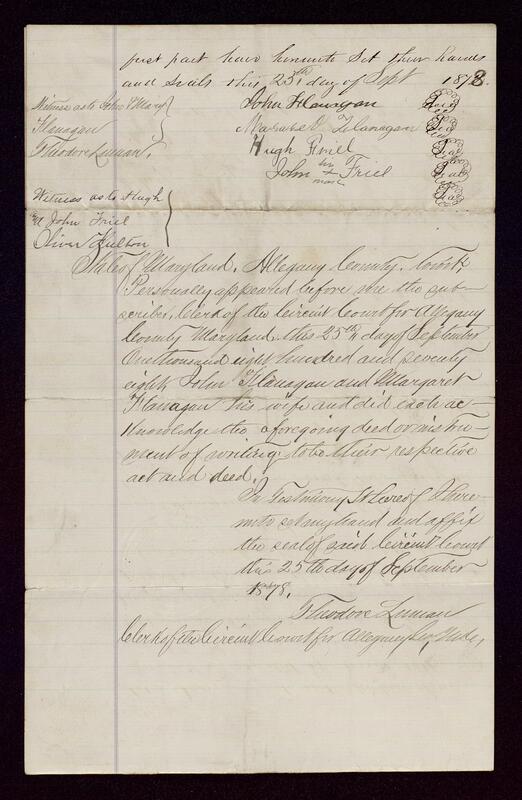 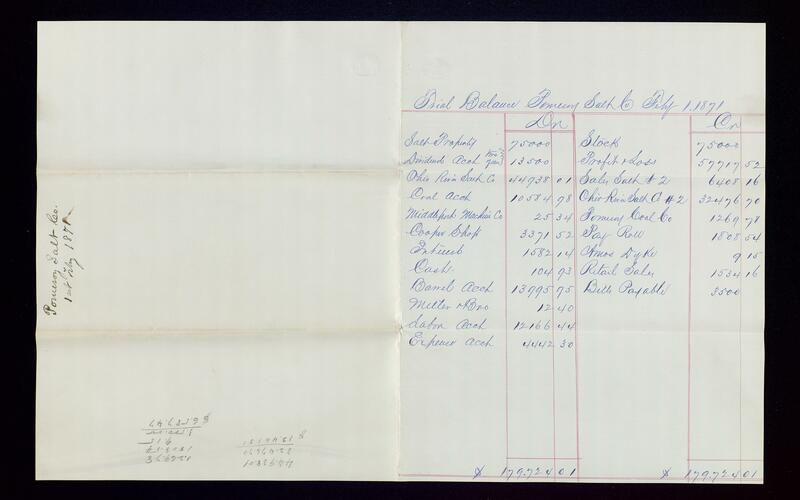 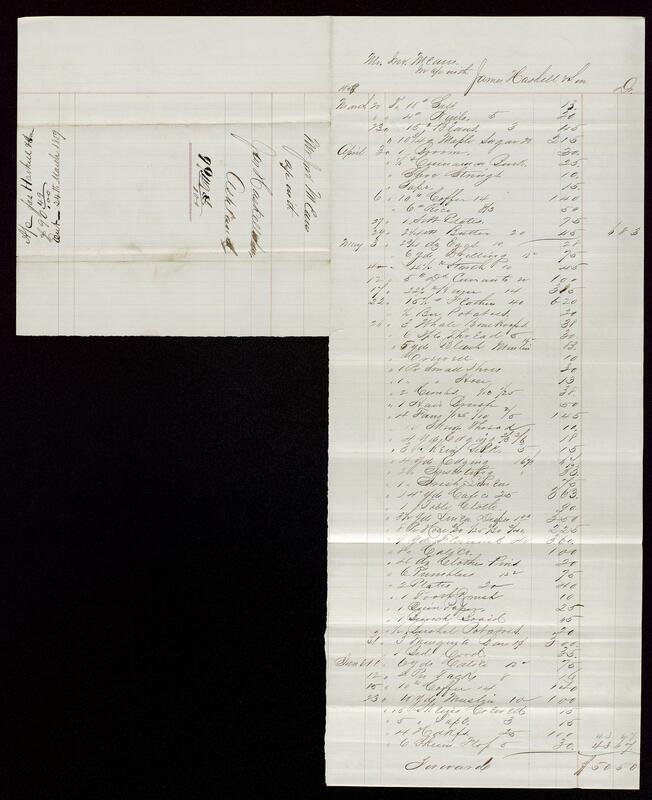 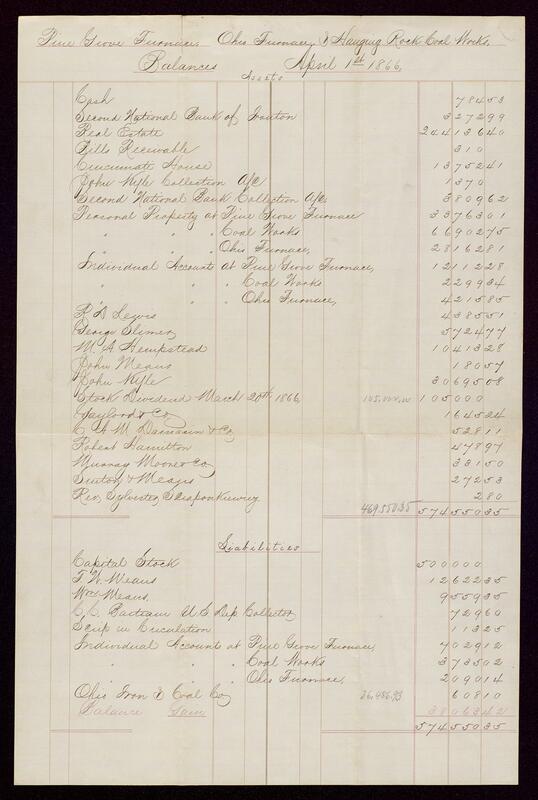 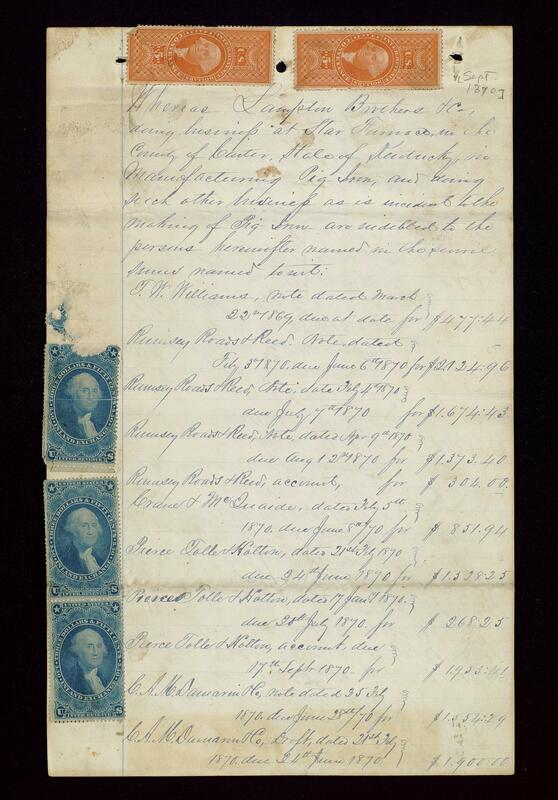 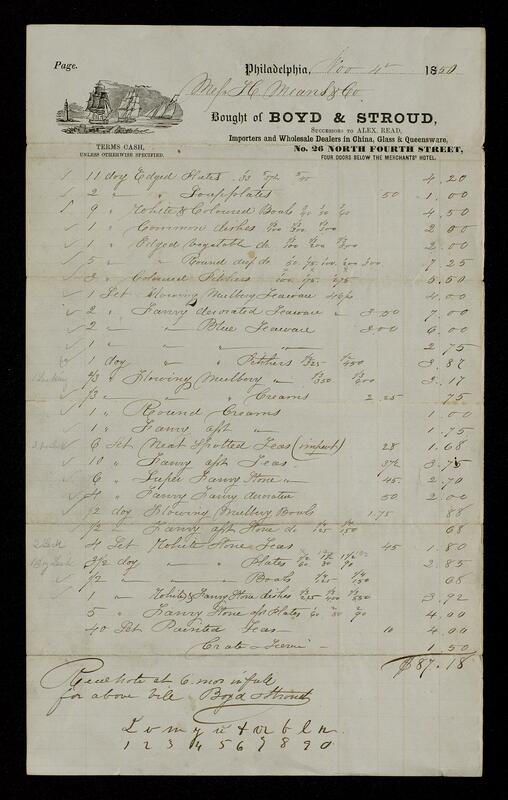 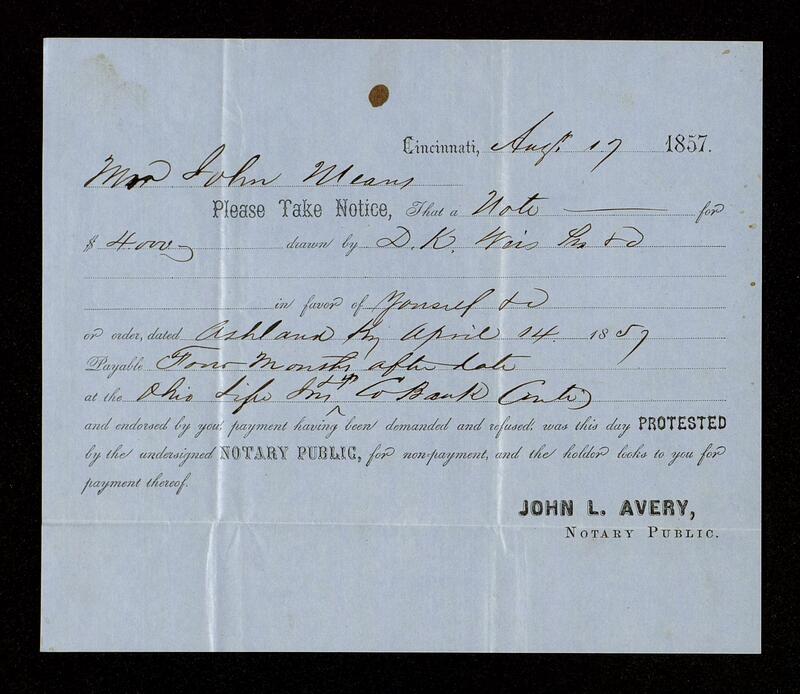 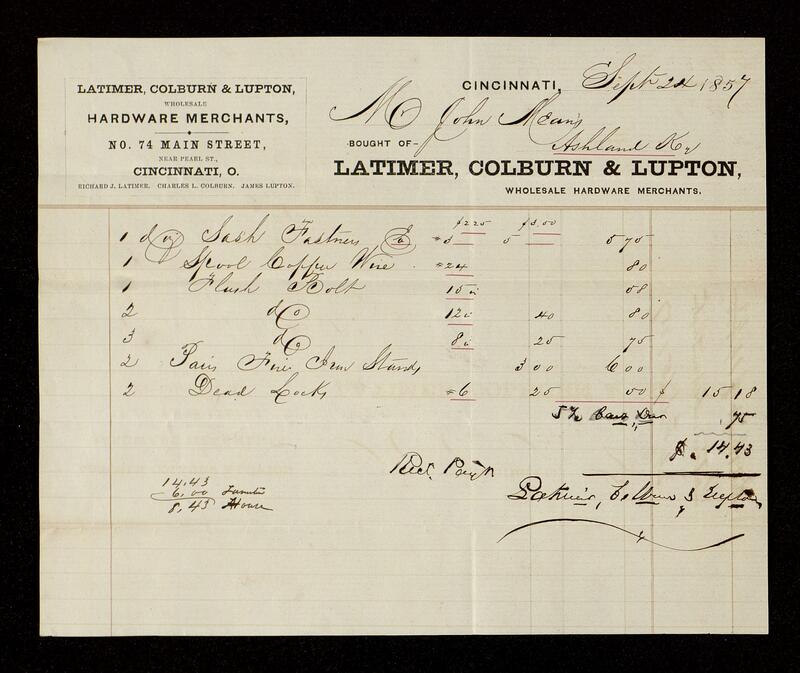 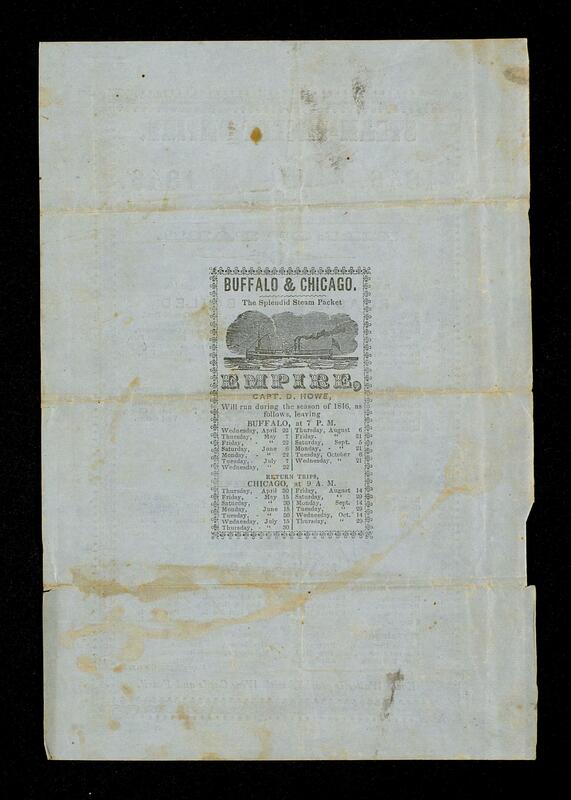 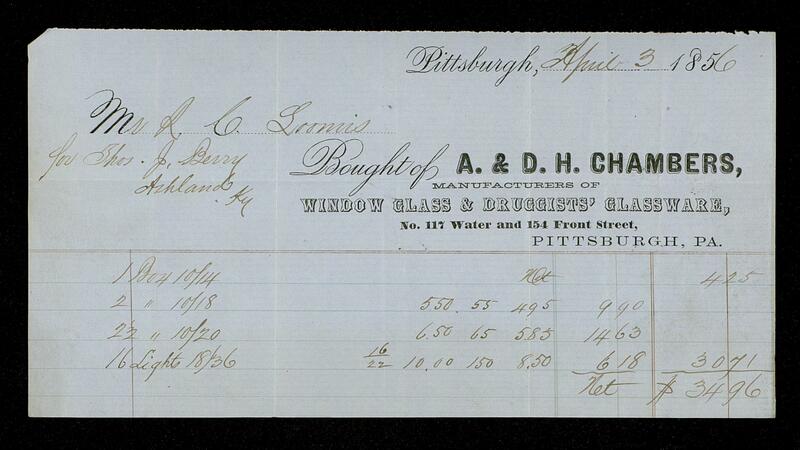 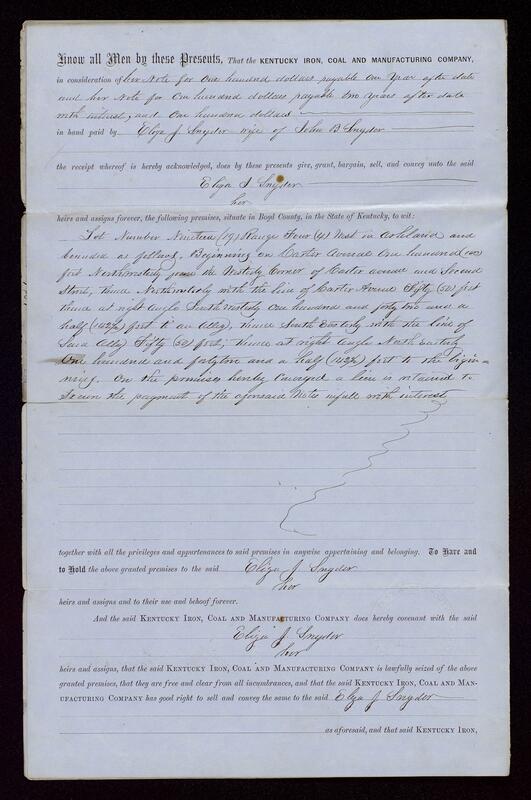 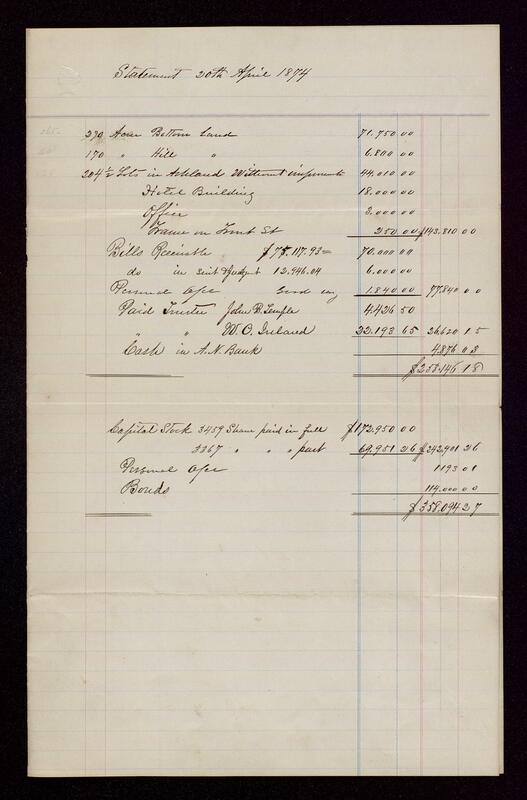 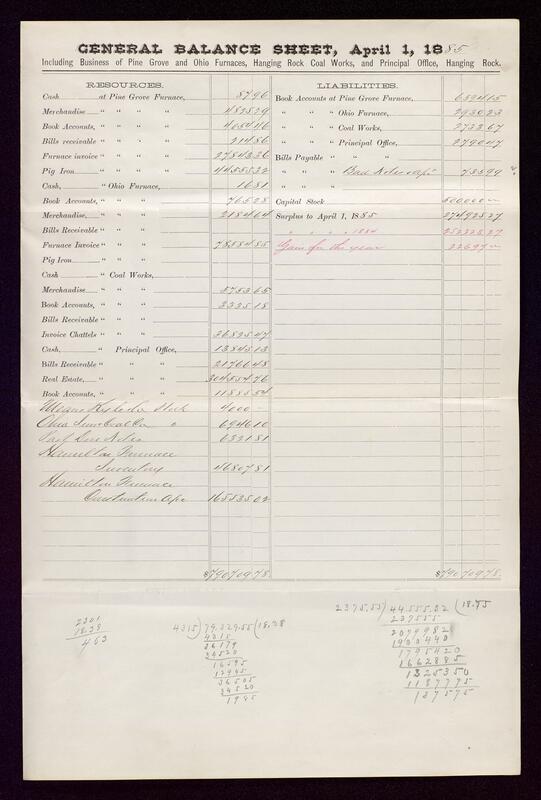 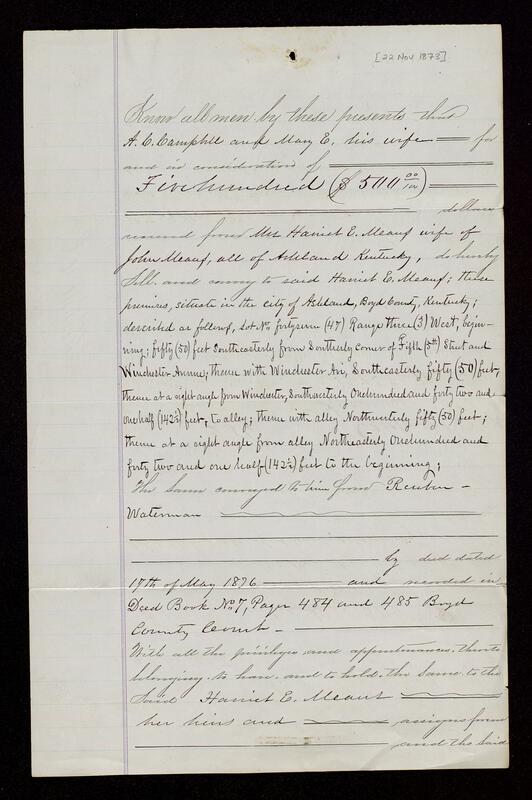 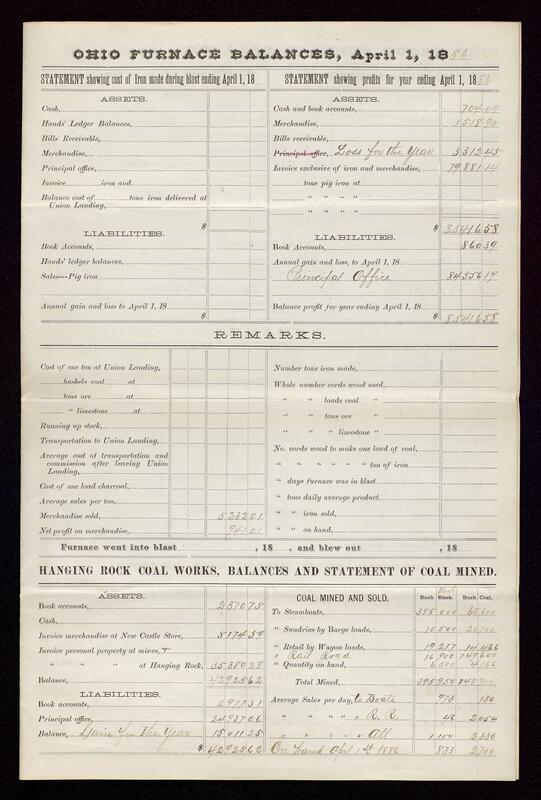 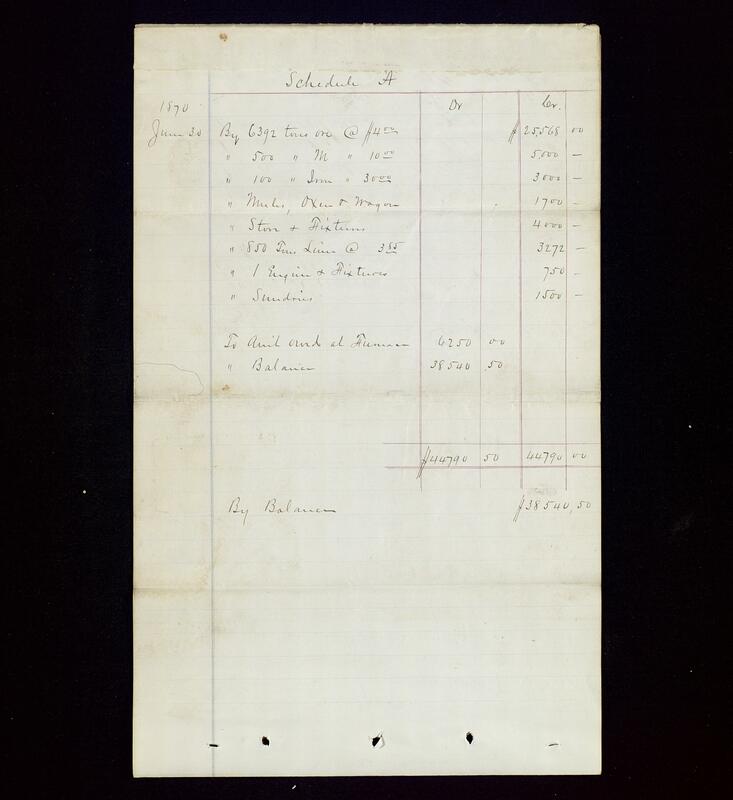 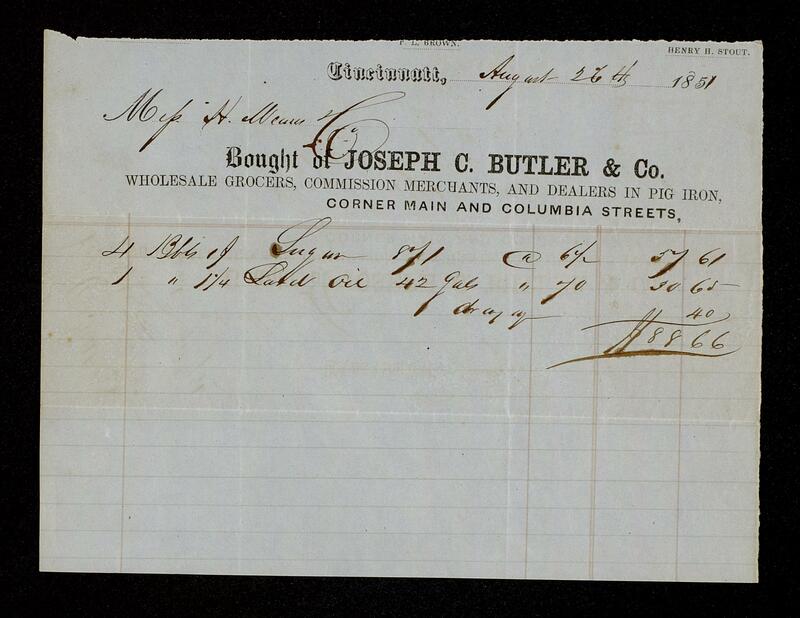 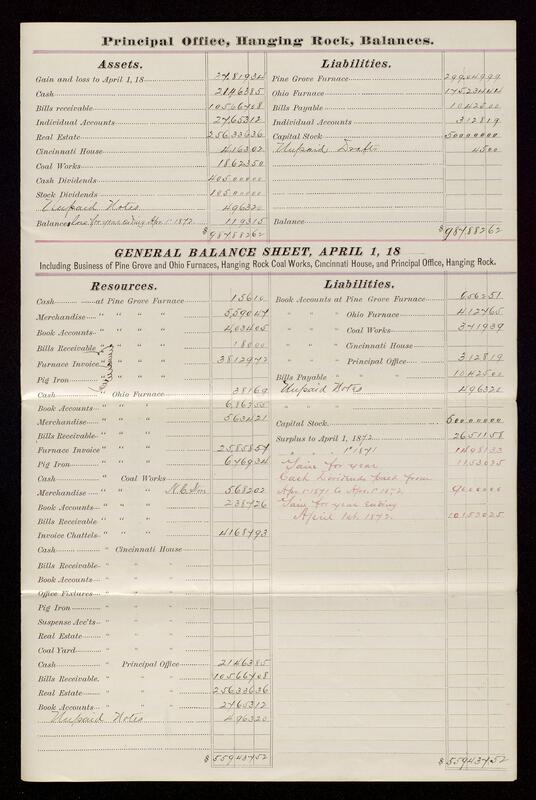 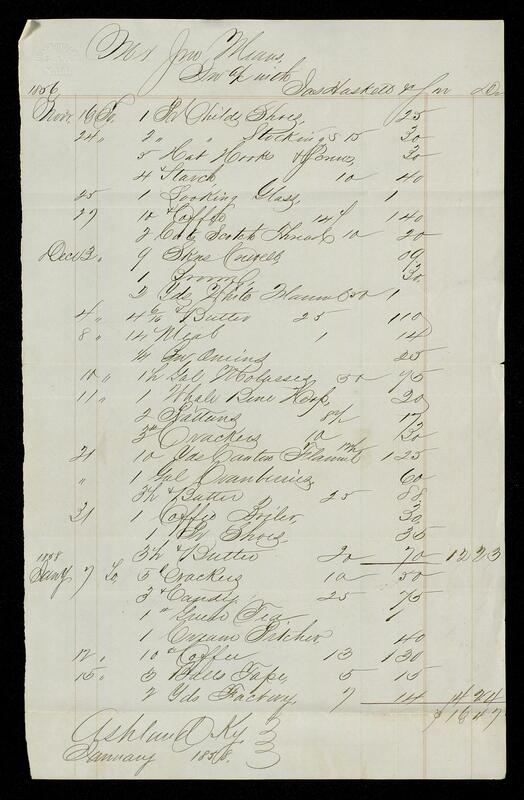 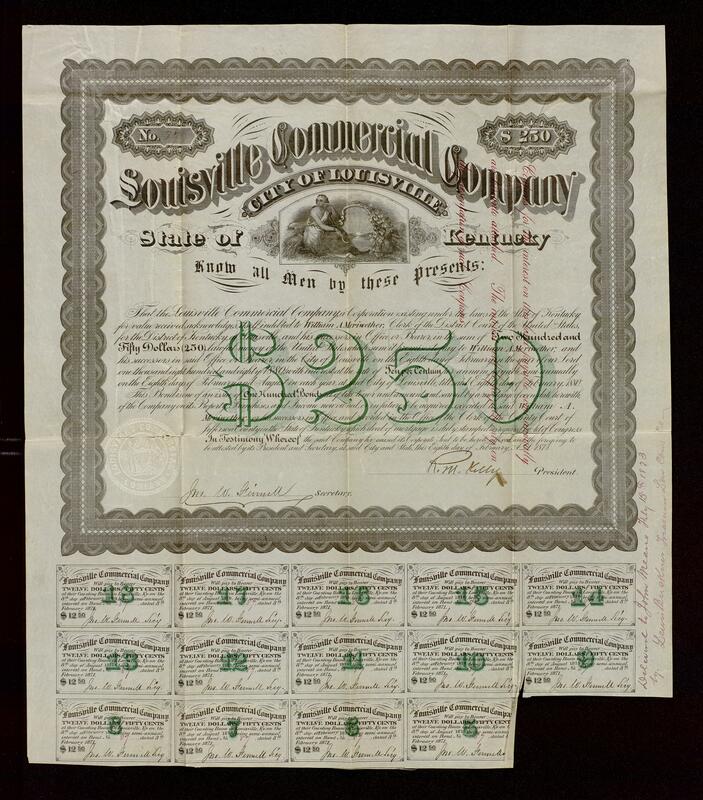 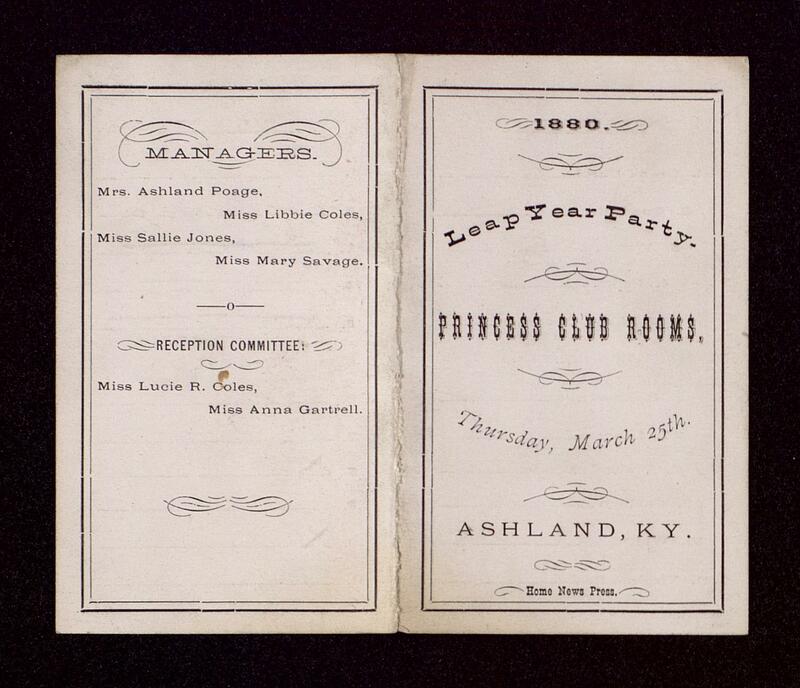 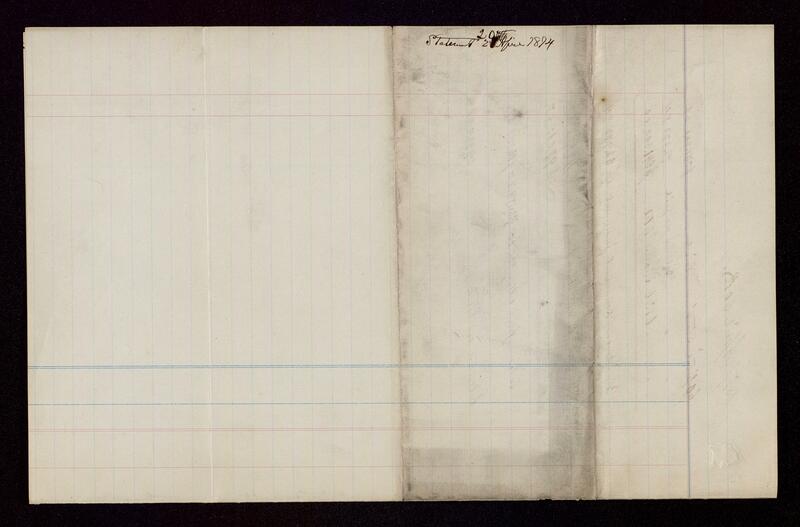 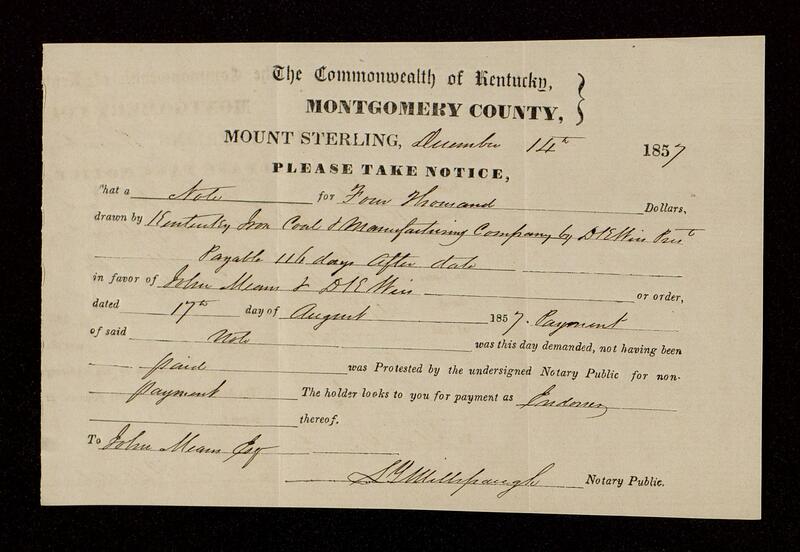 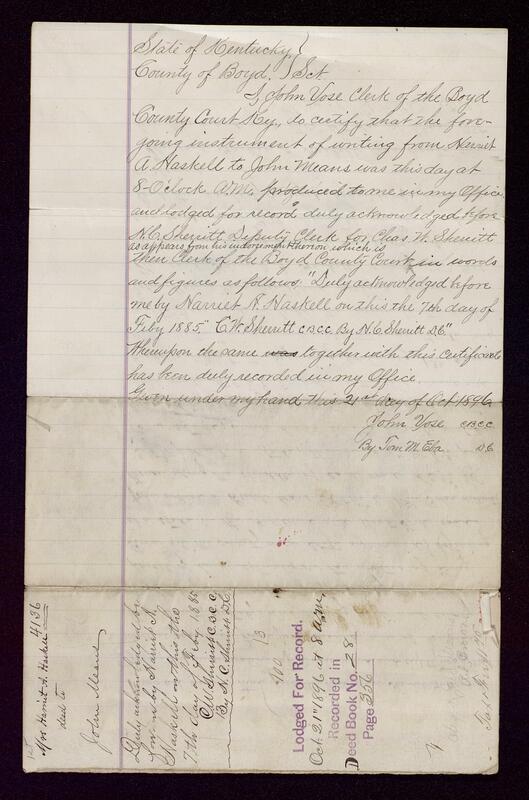 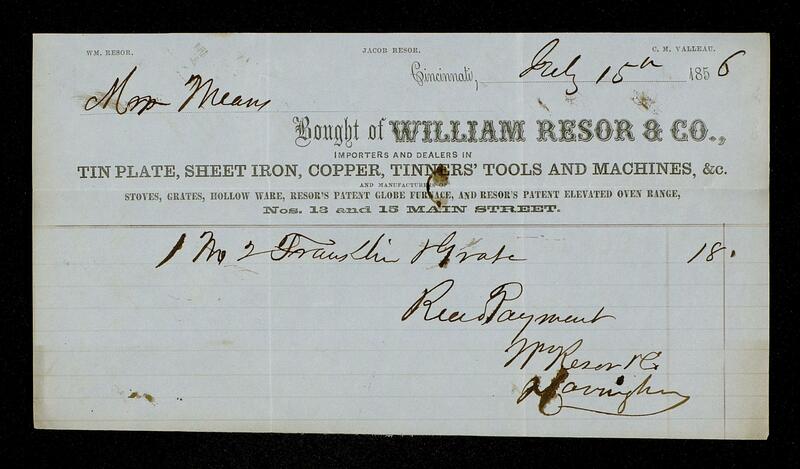 There are more papers of the Kentucky Iron, Coal and Manufacturing Company as well as other business correspondence and financial reports concerning the Means family's various business ventures. 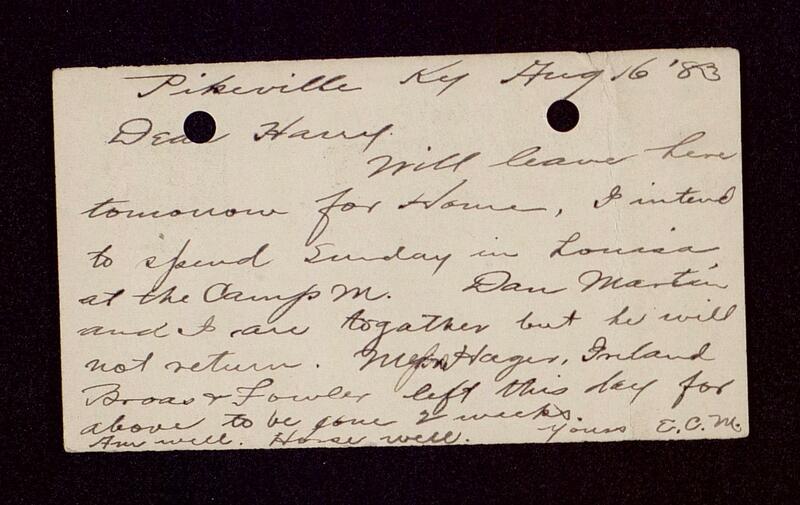 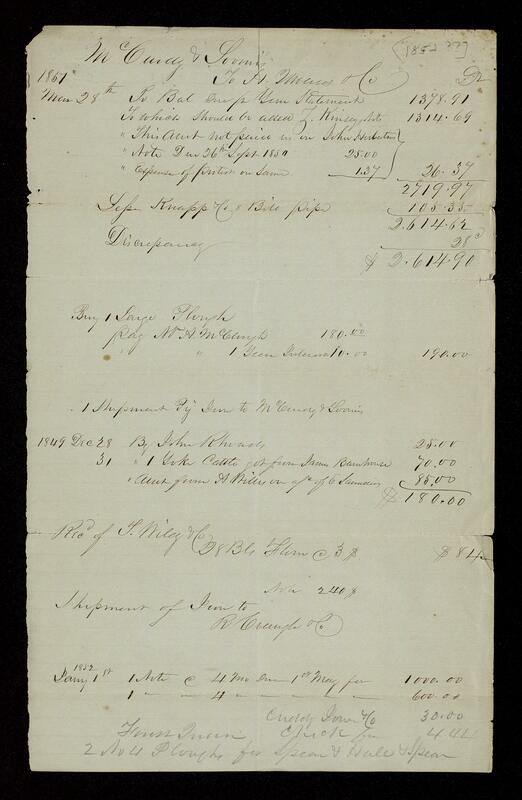 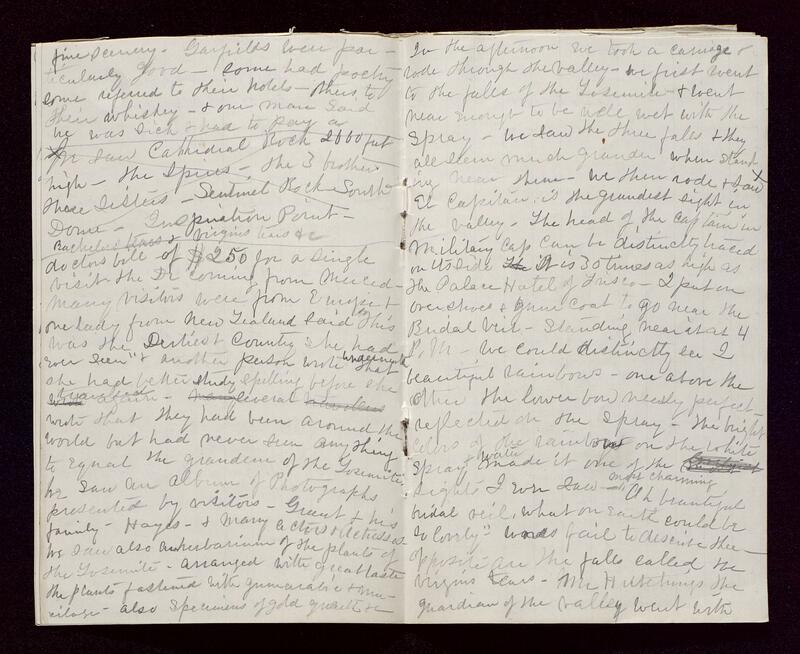 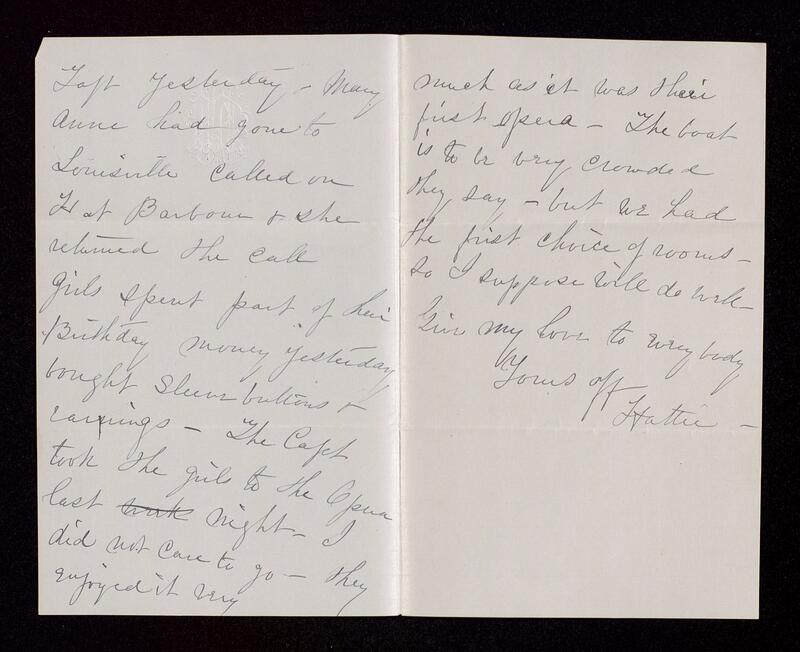 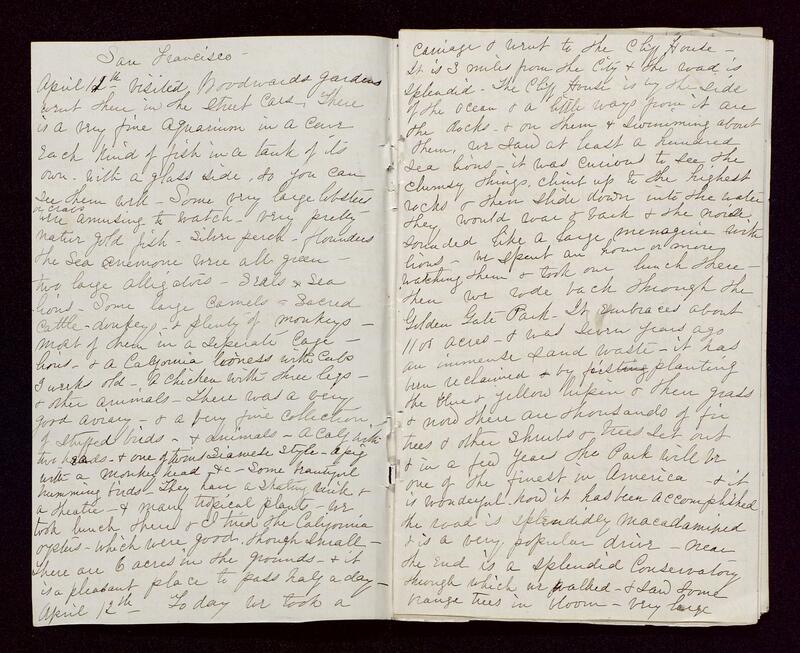 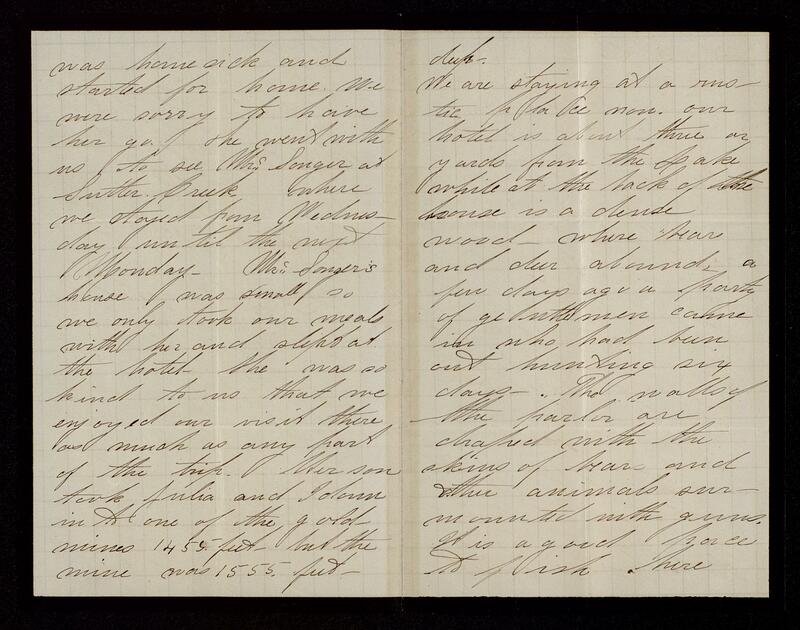 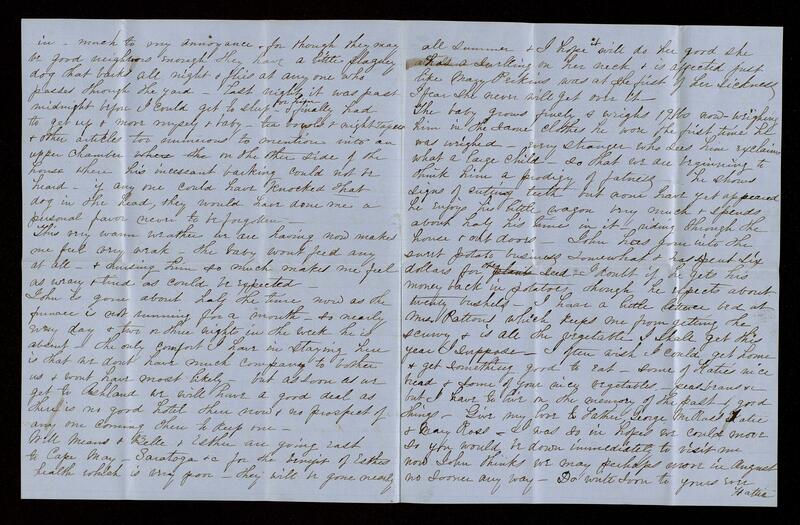 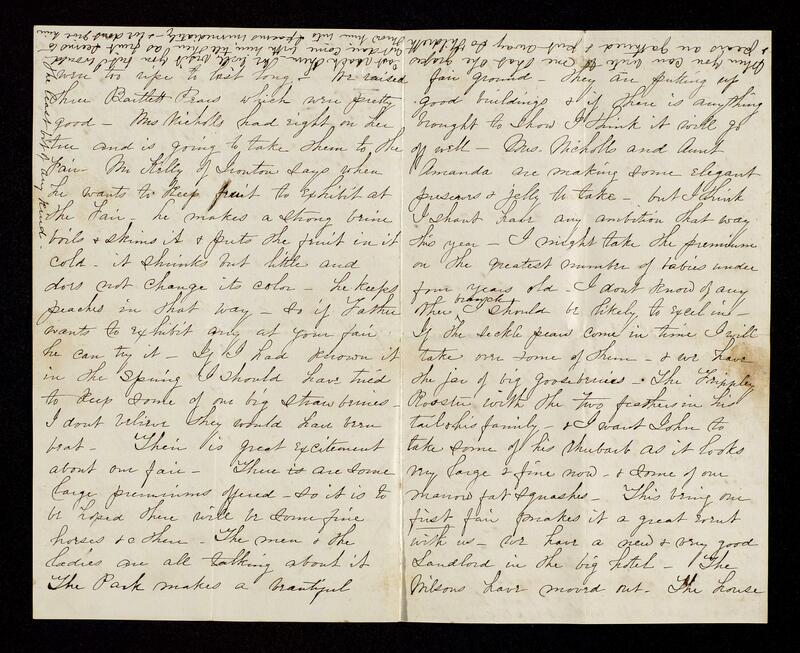 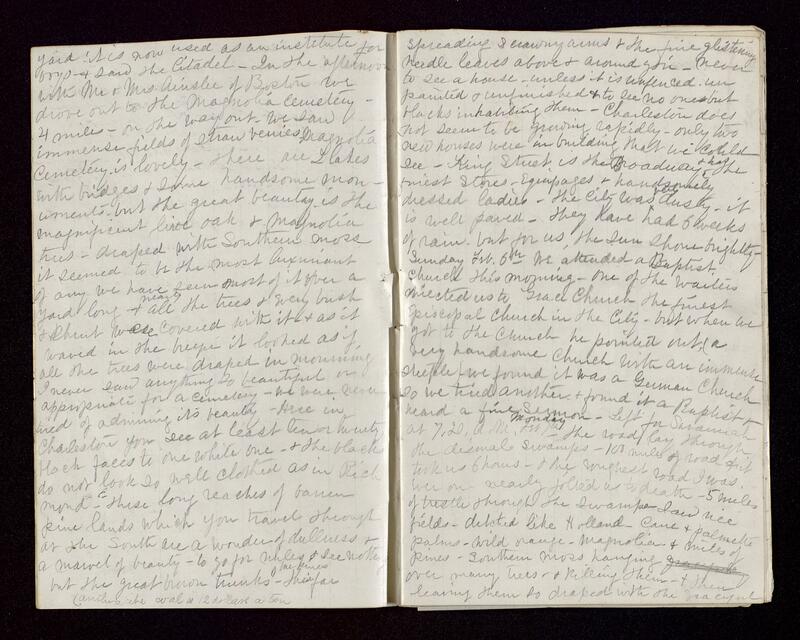 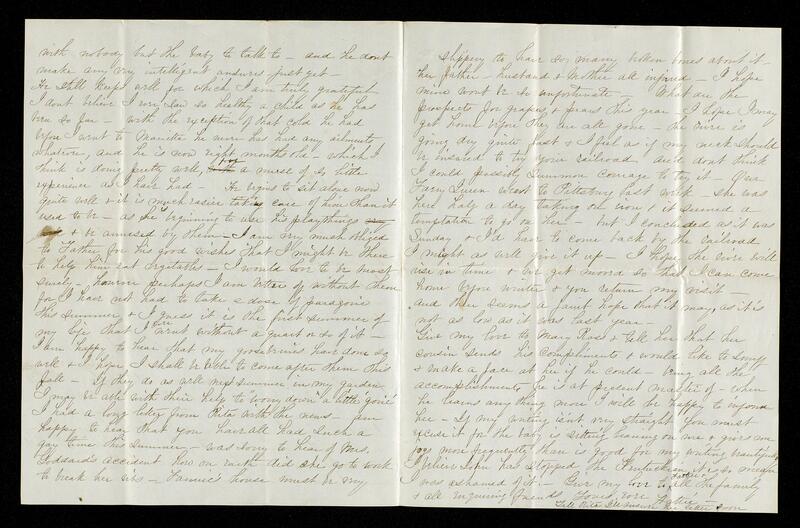 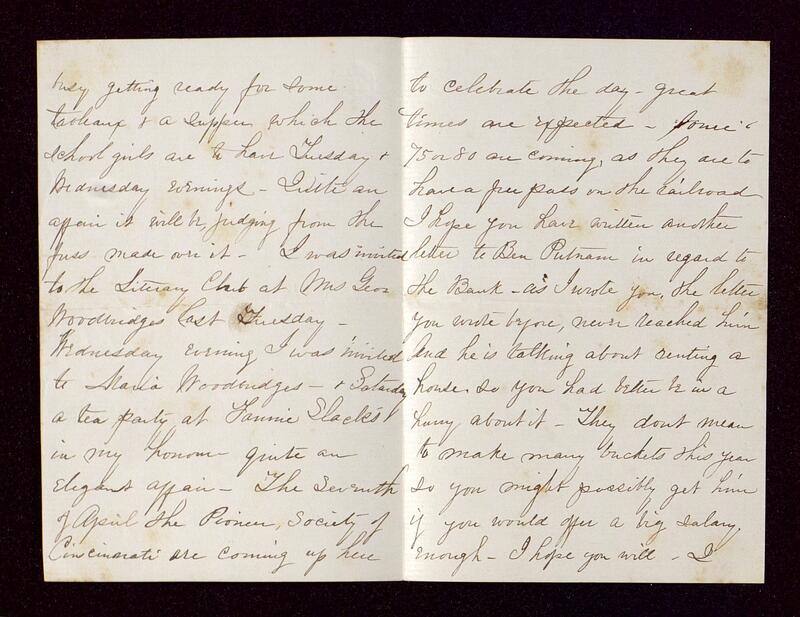 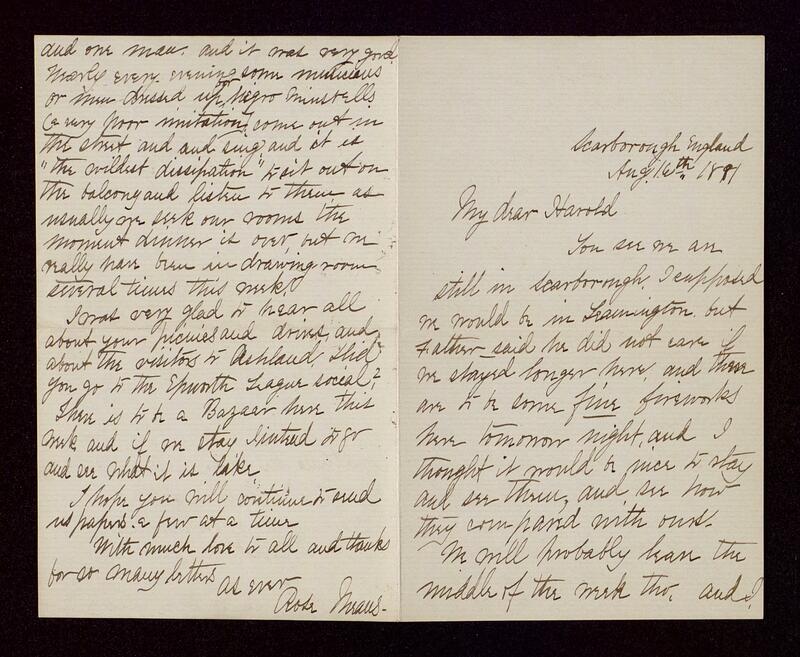 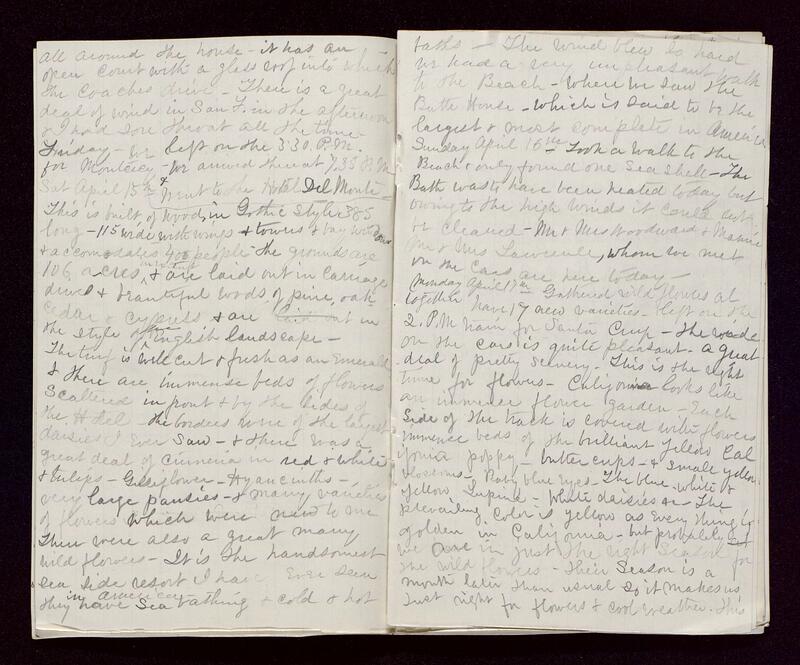 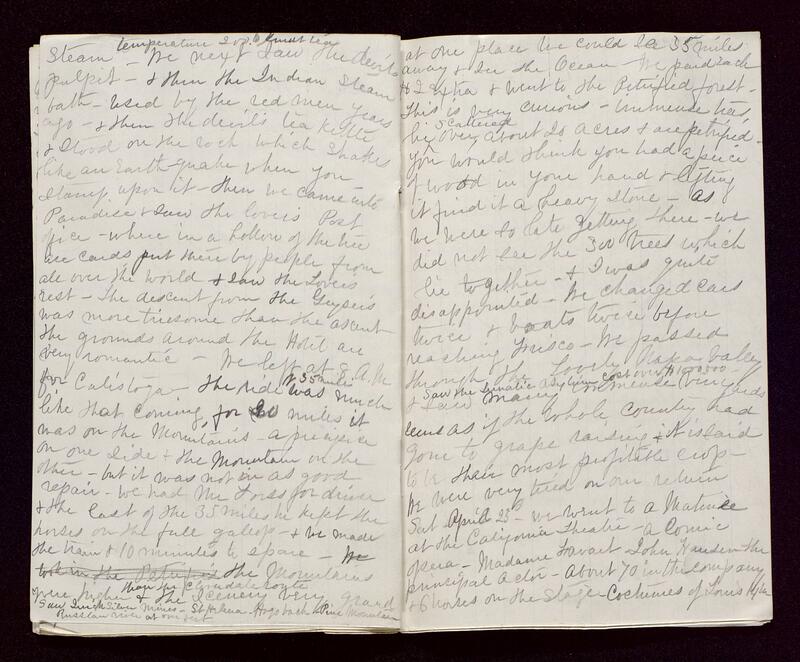 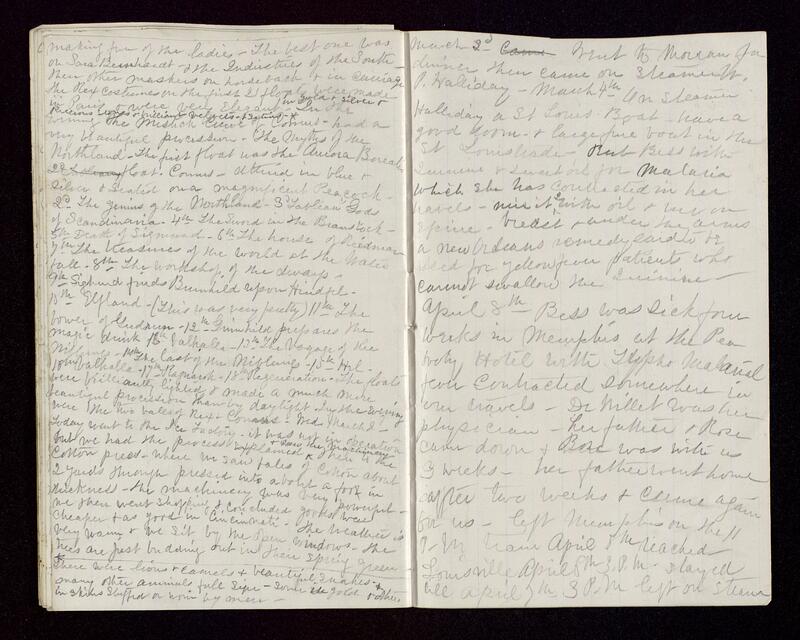 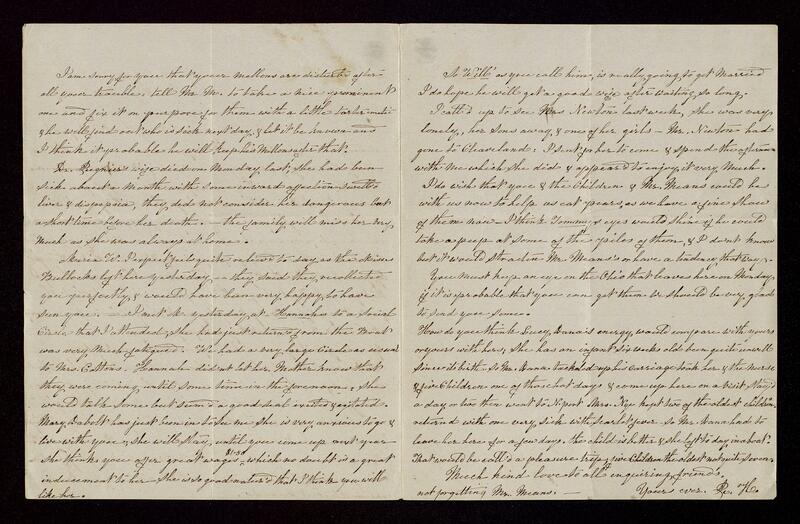 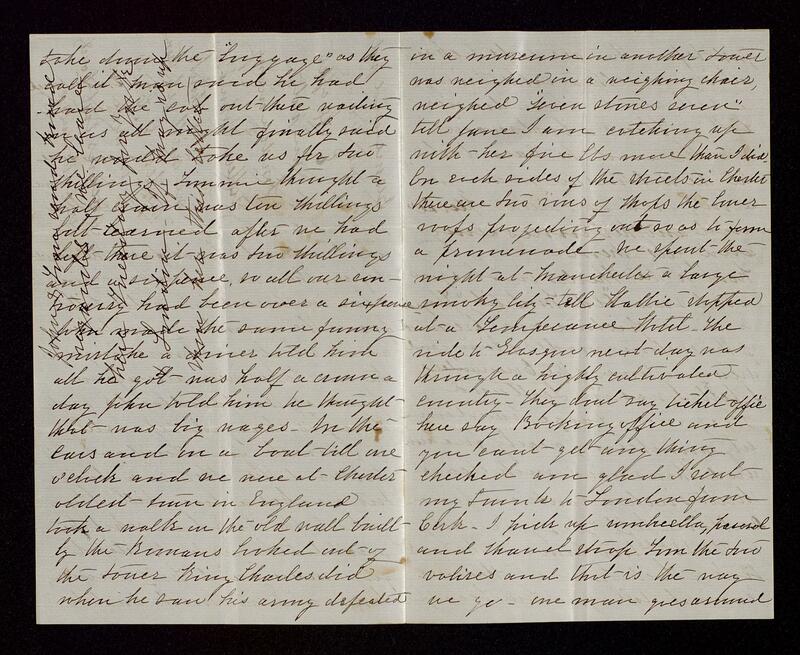 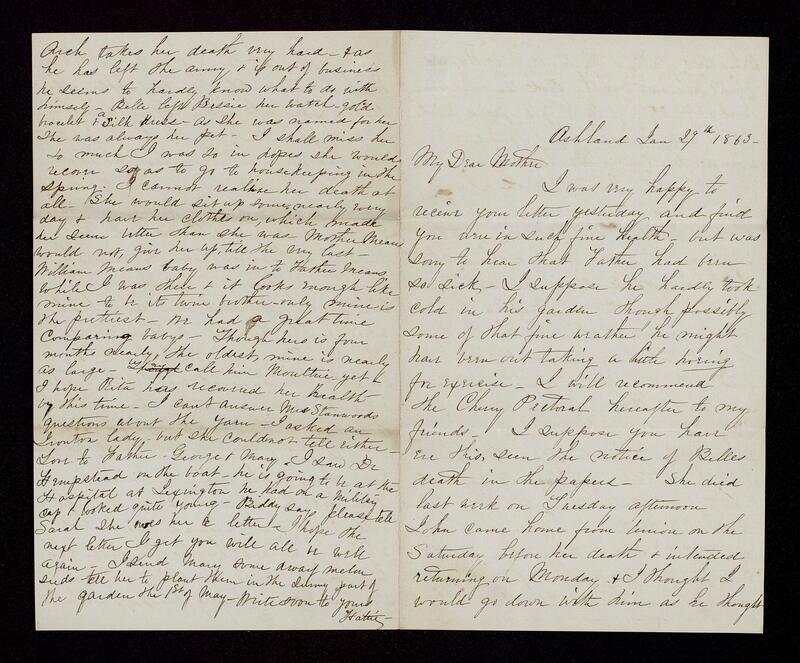 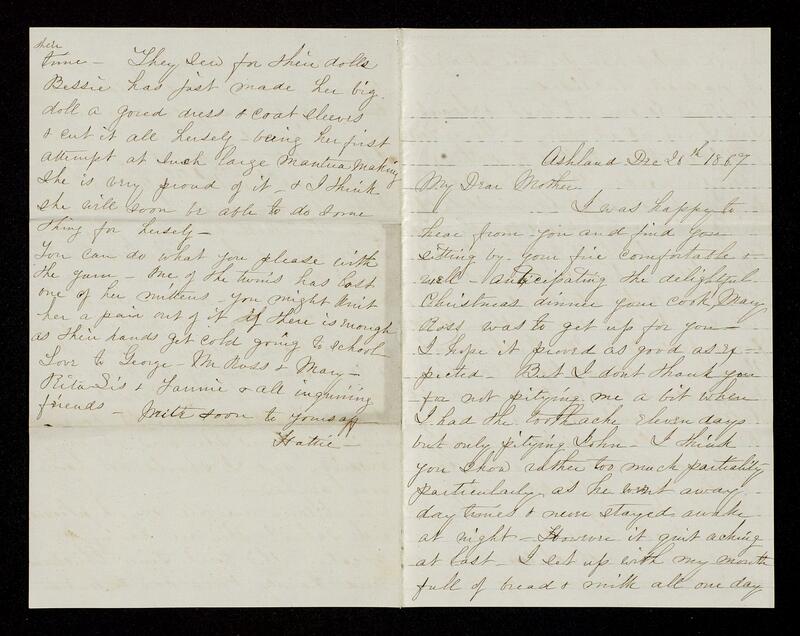 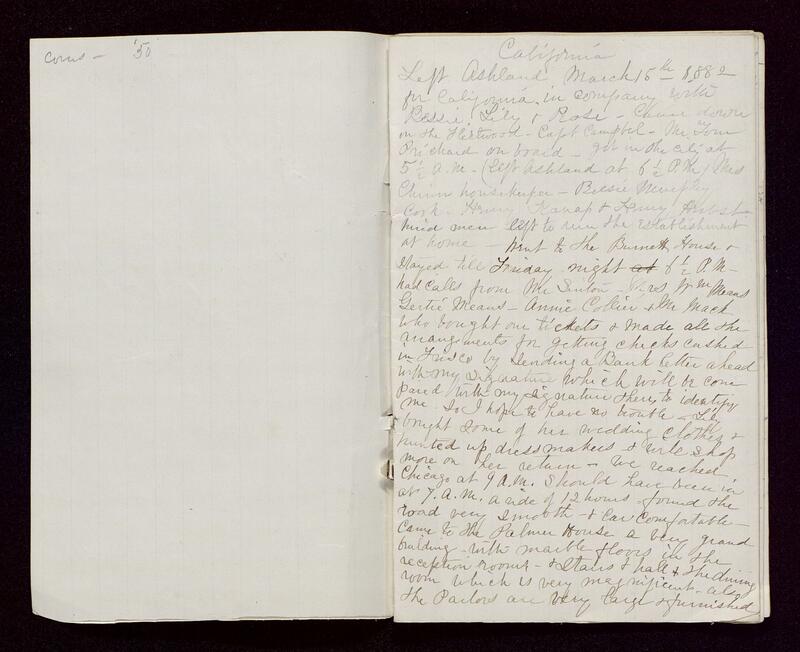 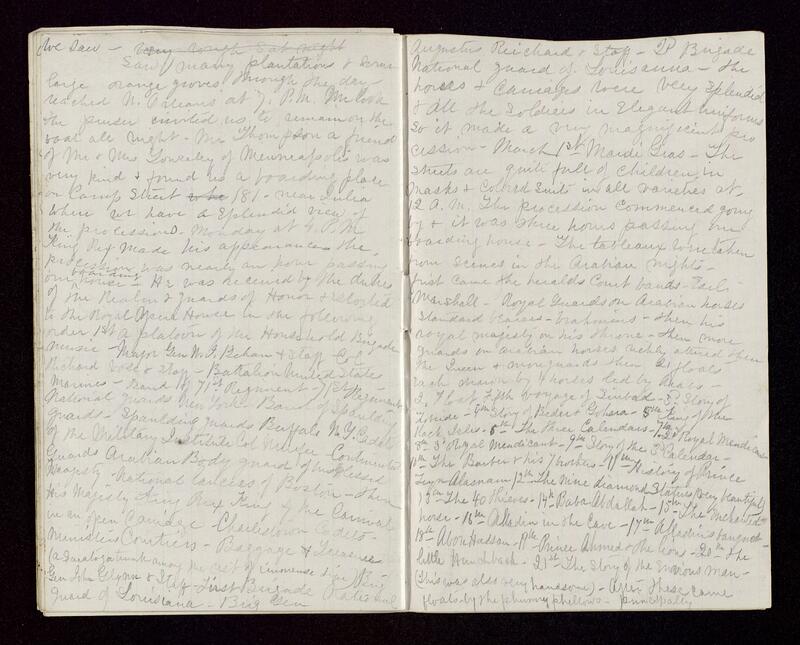 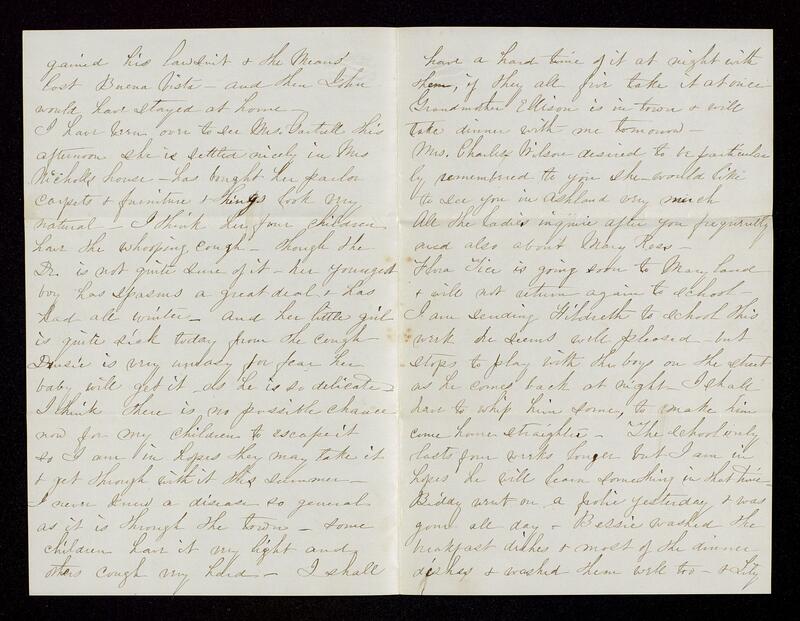 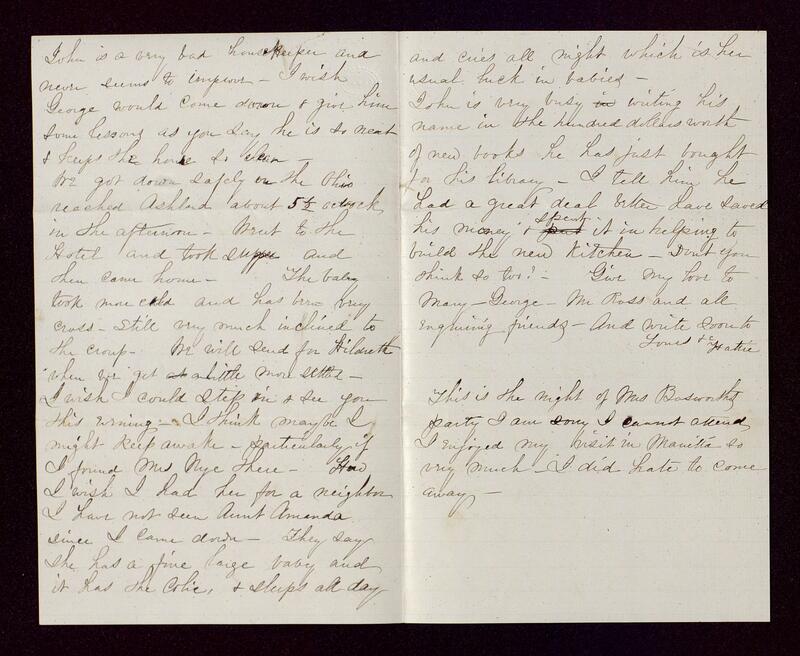 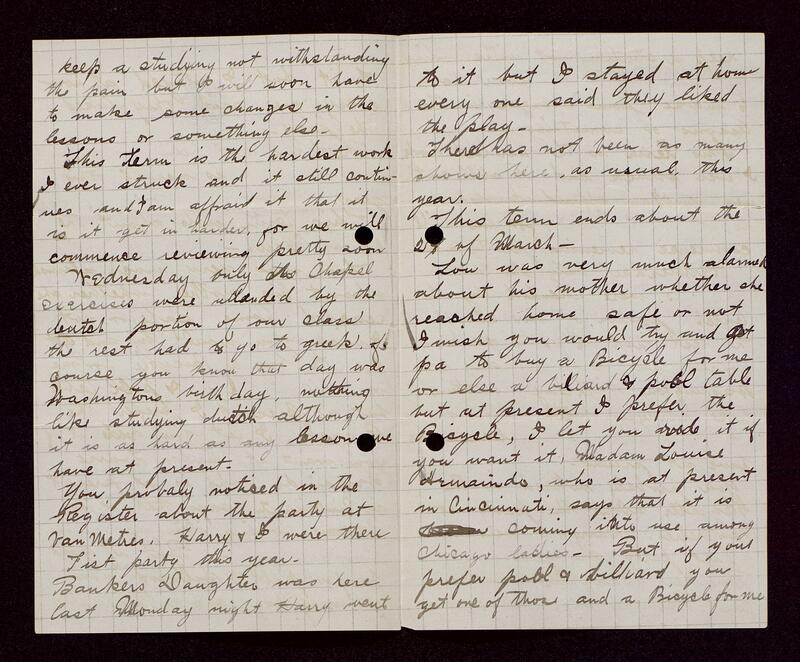 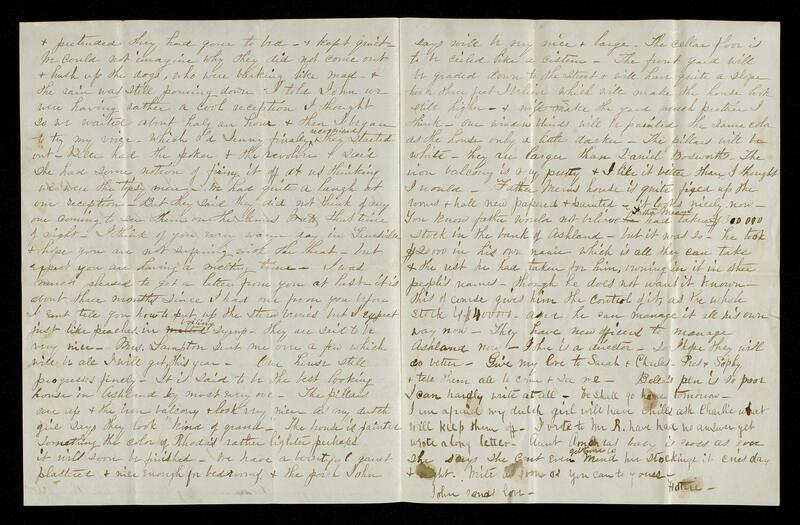 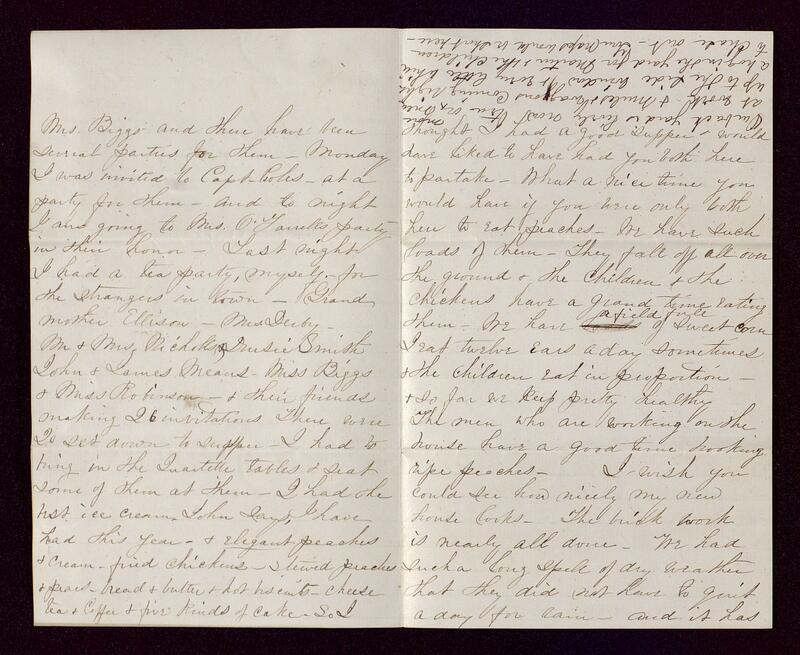 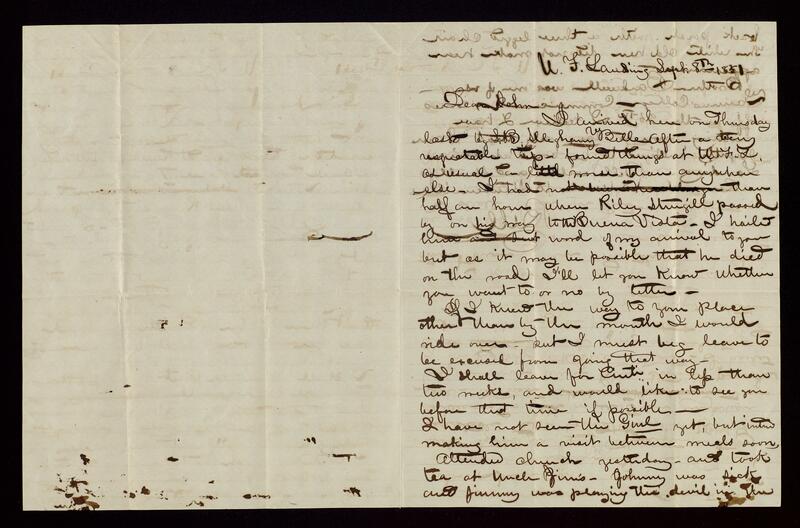 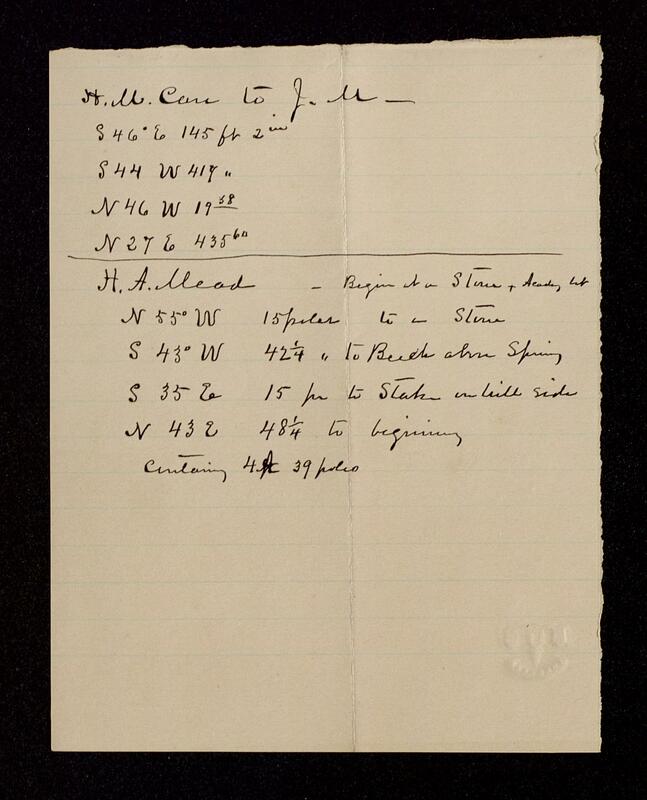 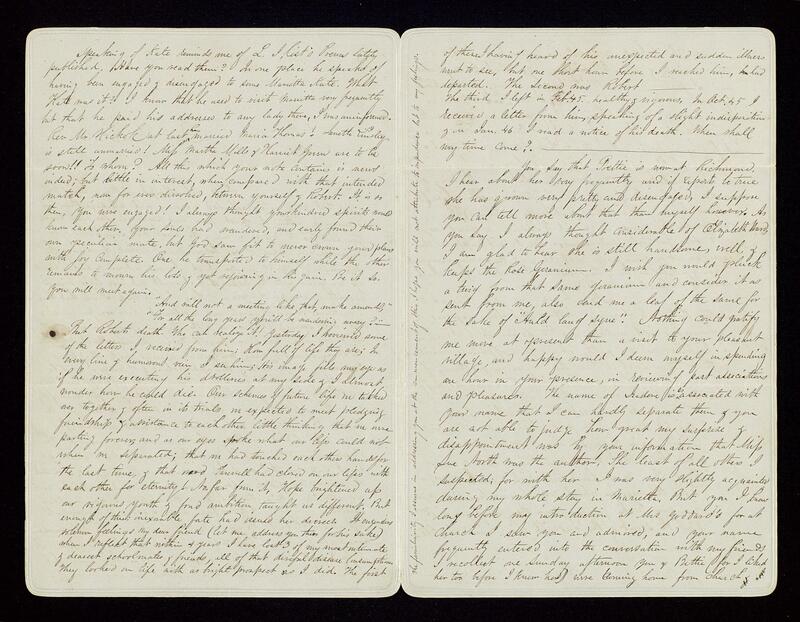 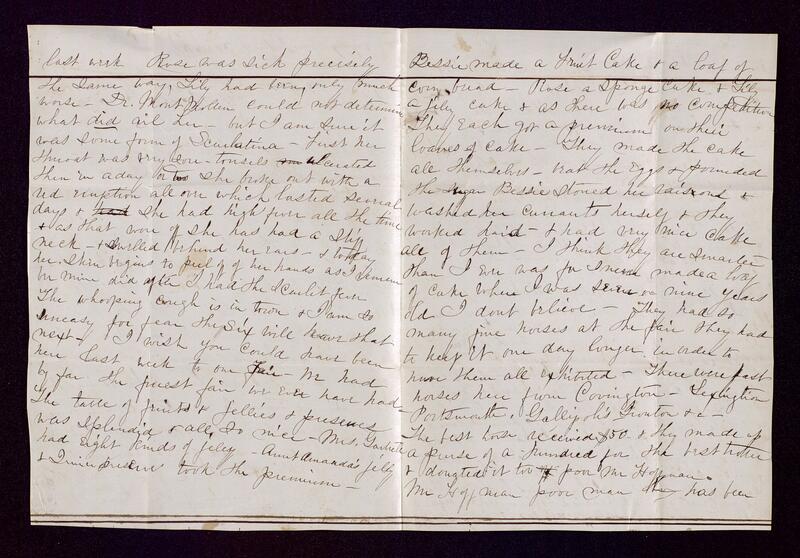 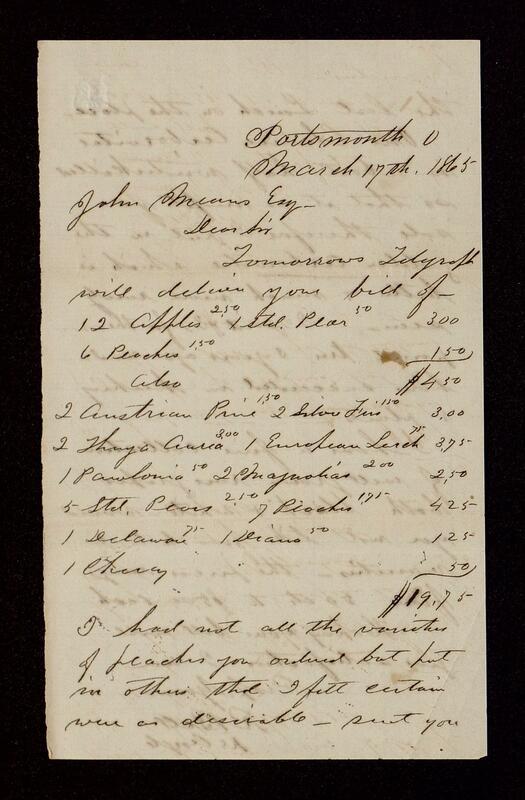 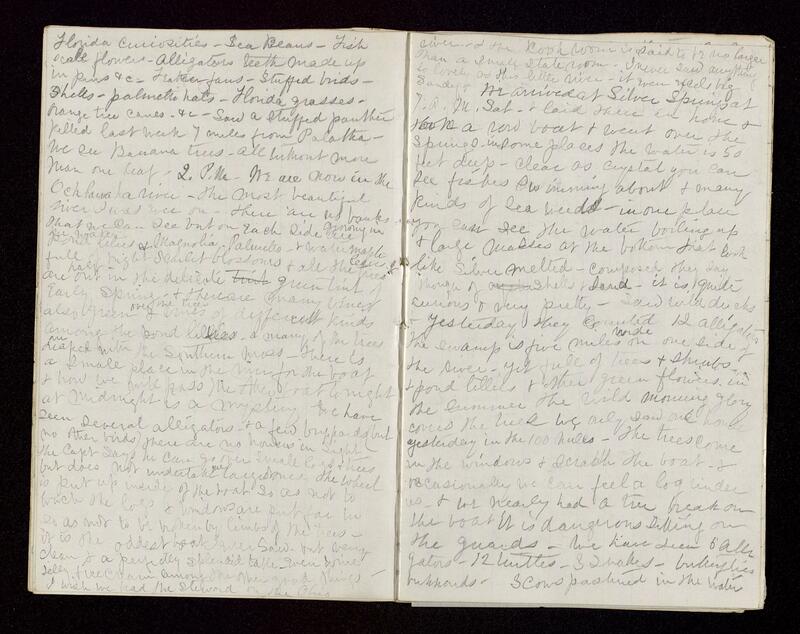 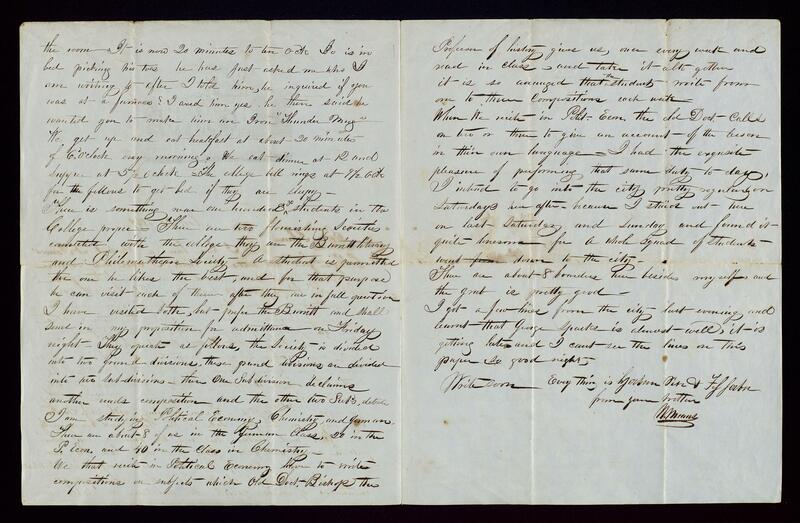 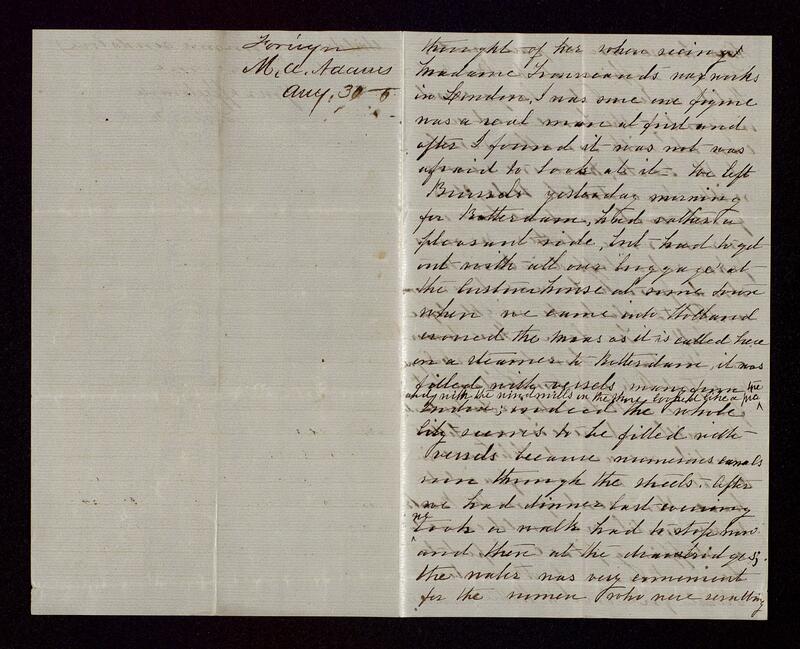 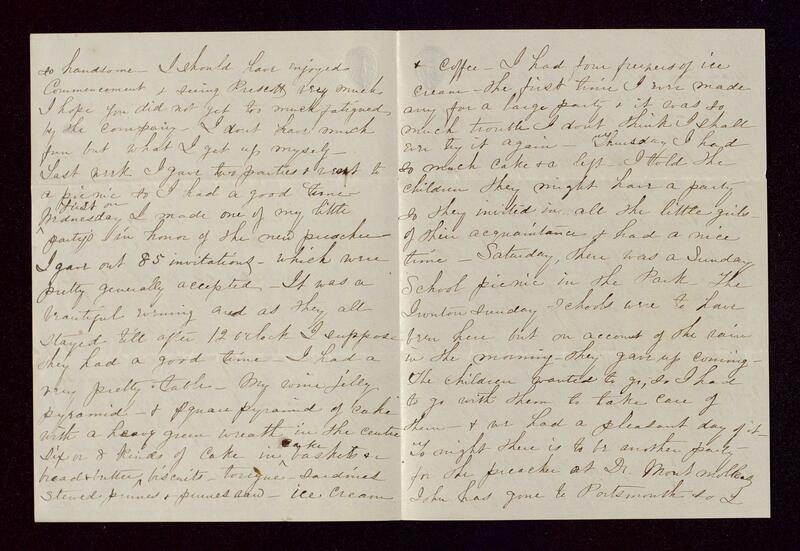 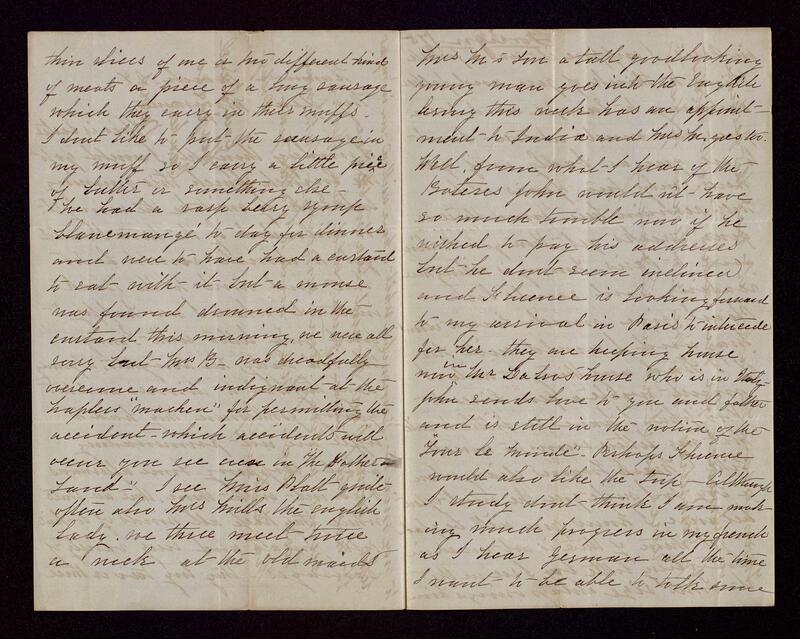 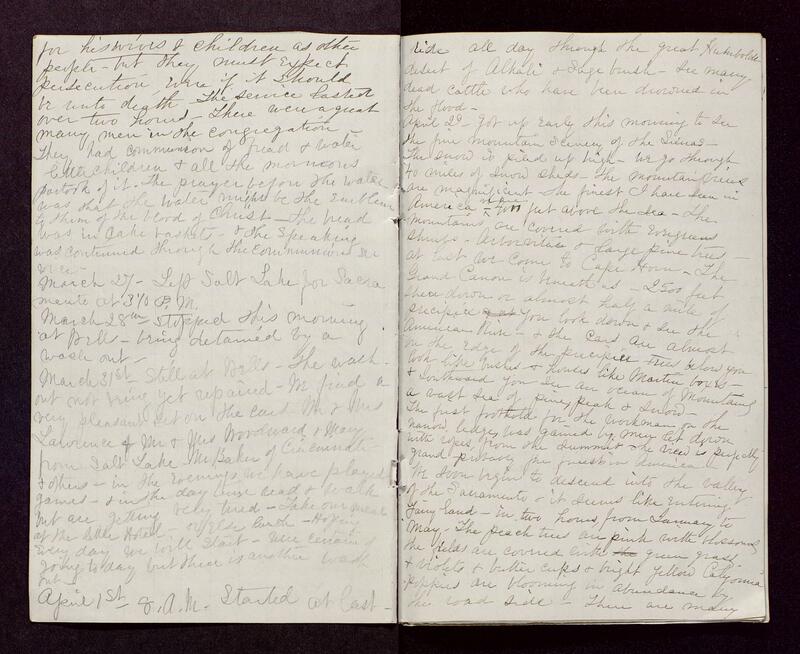 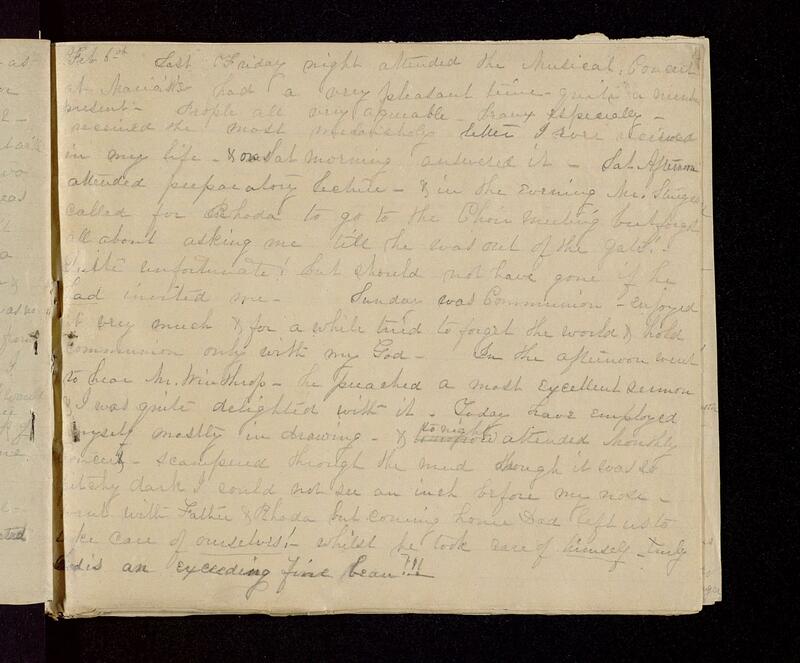 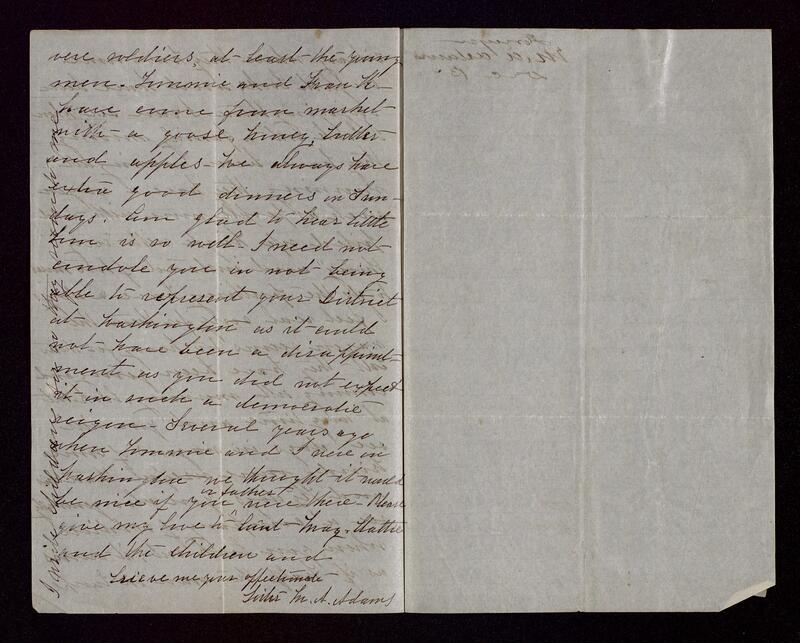 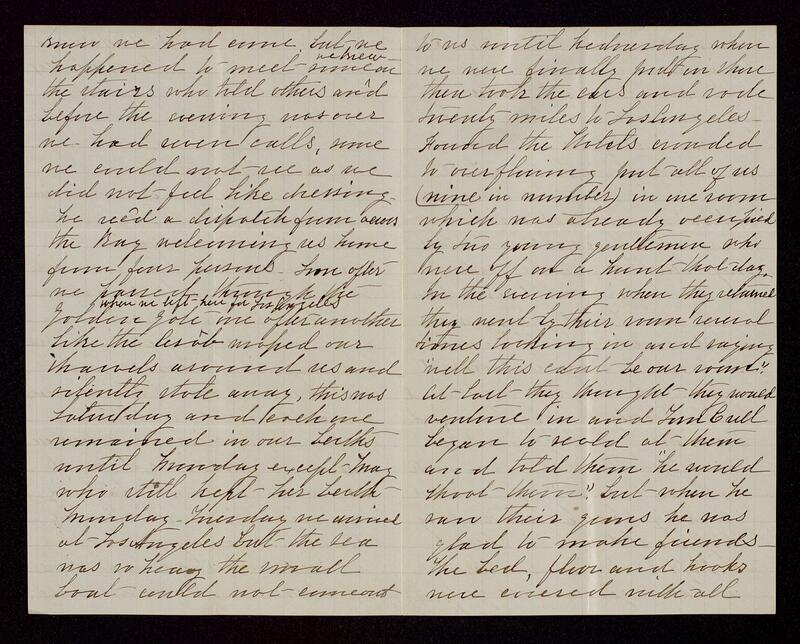 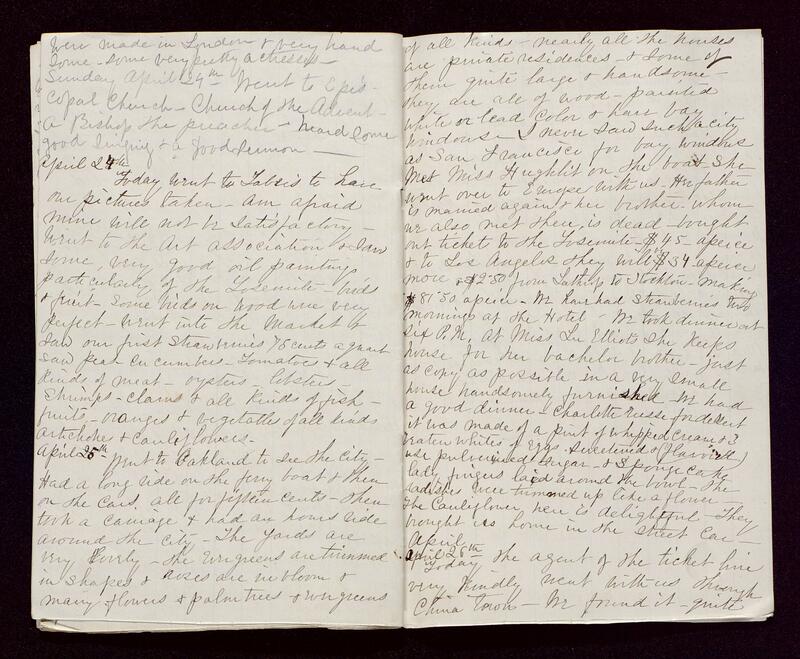 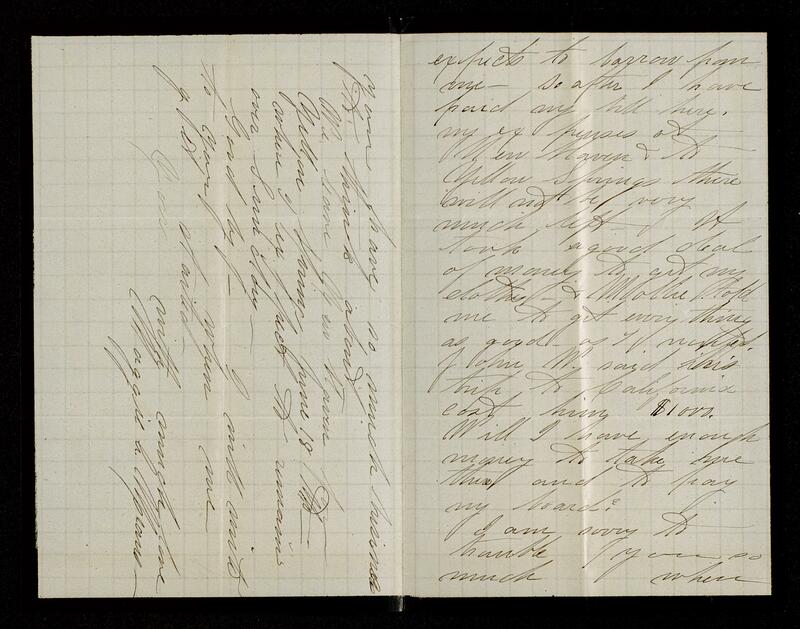 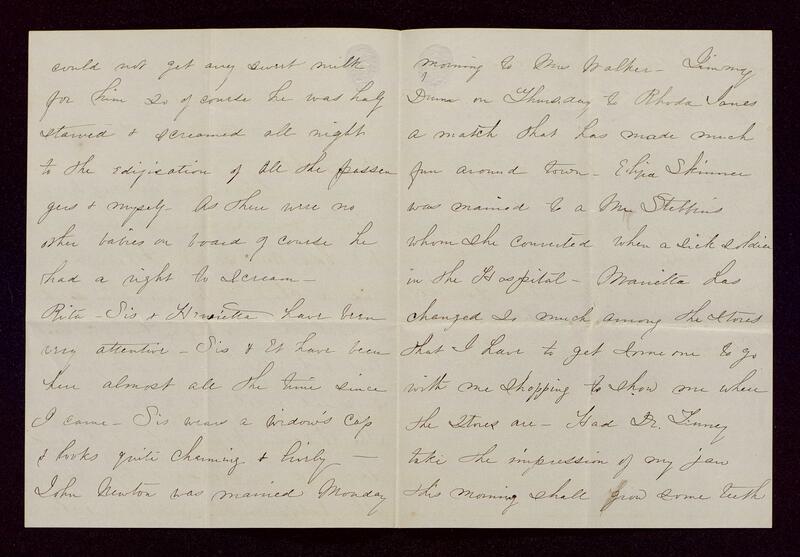 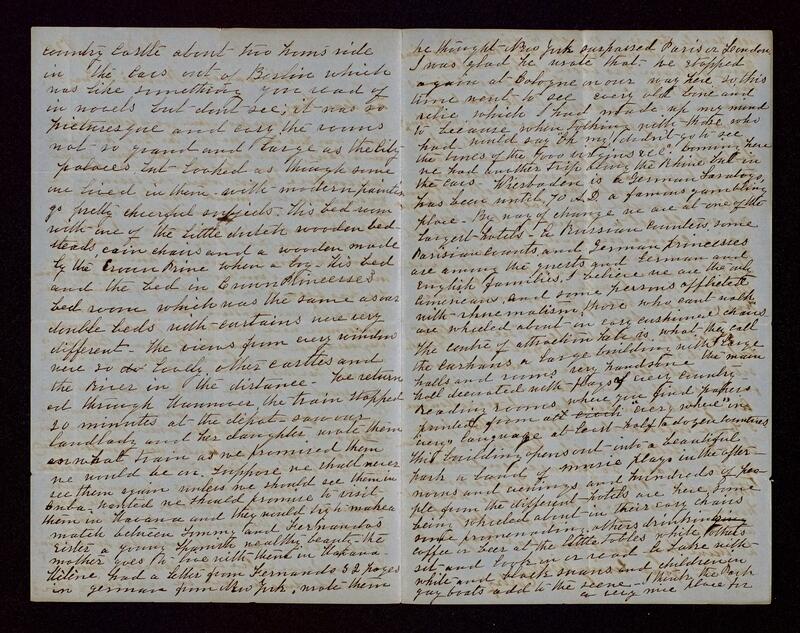 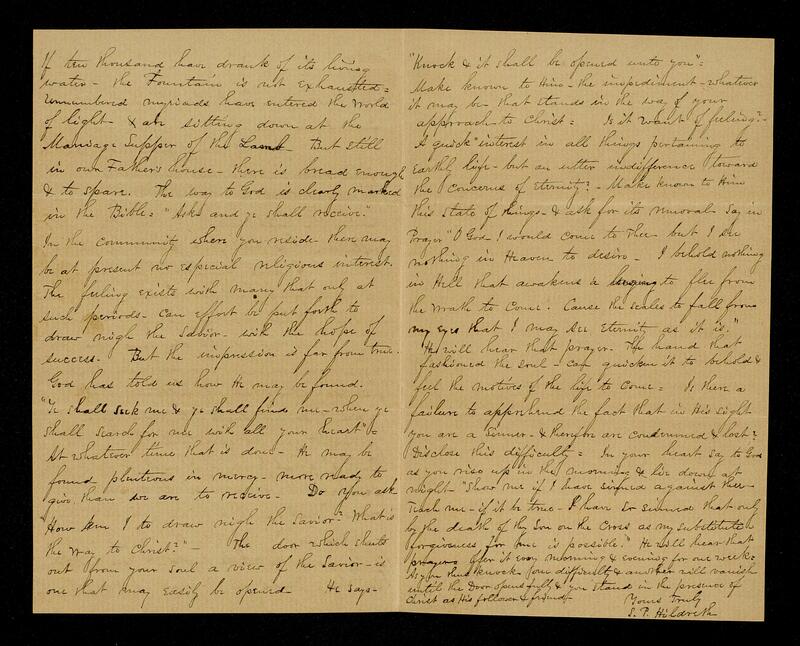 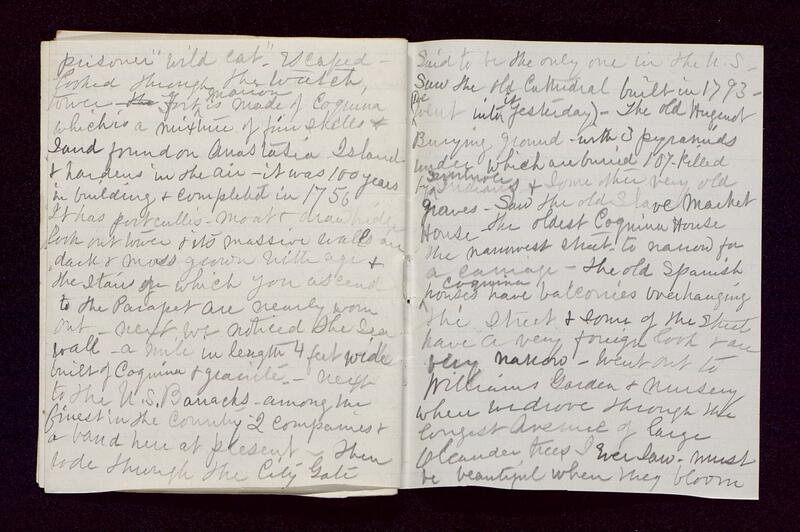 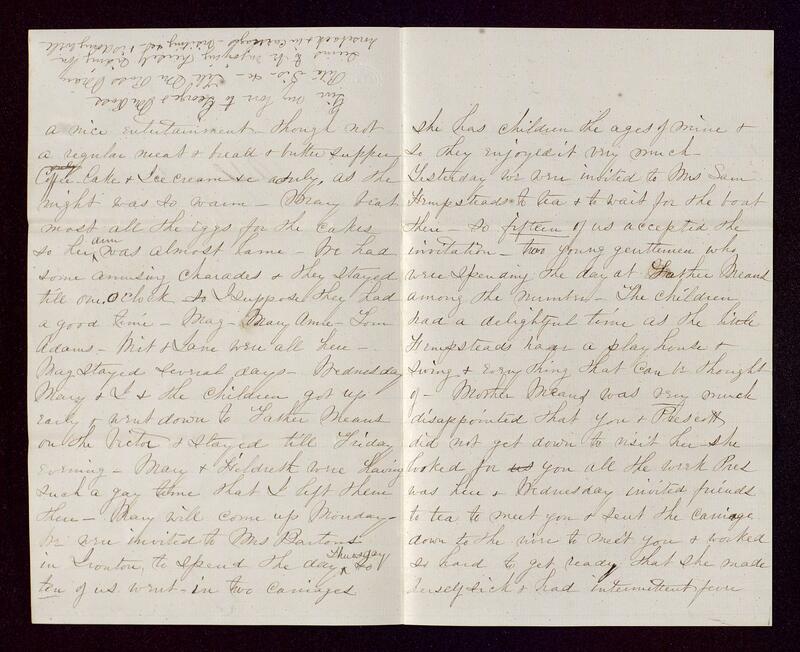 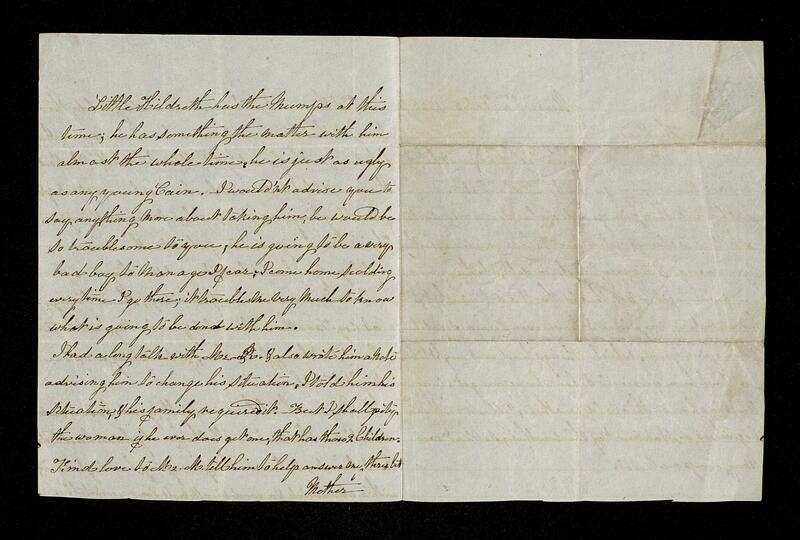 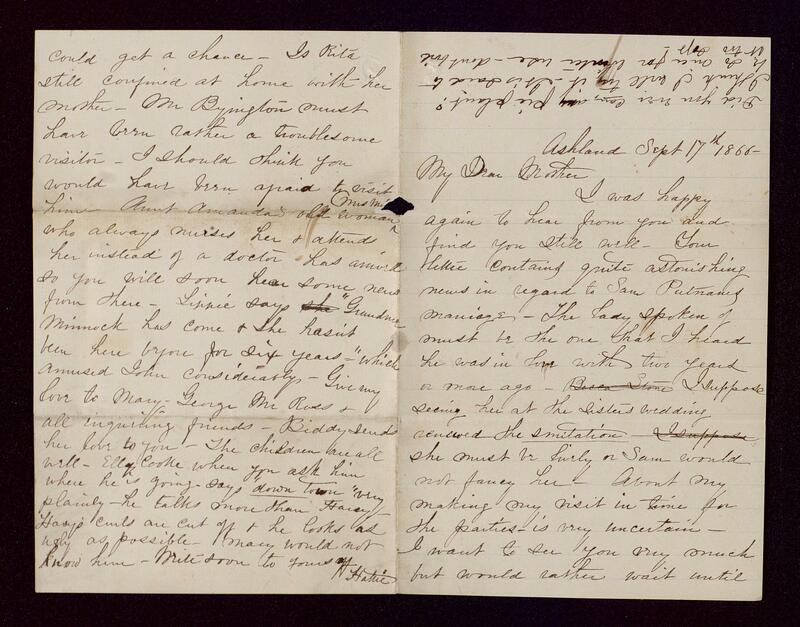 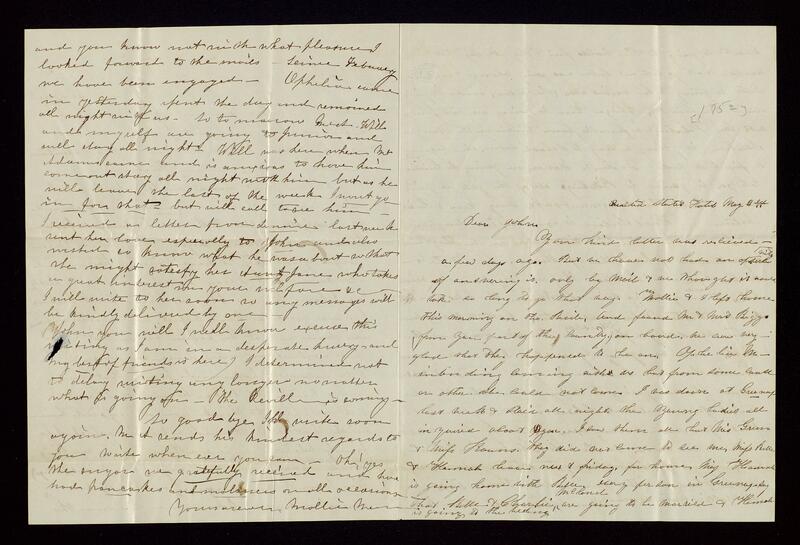 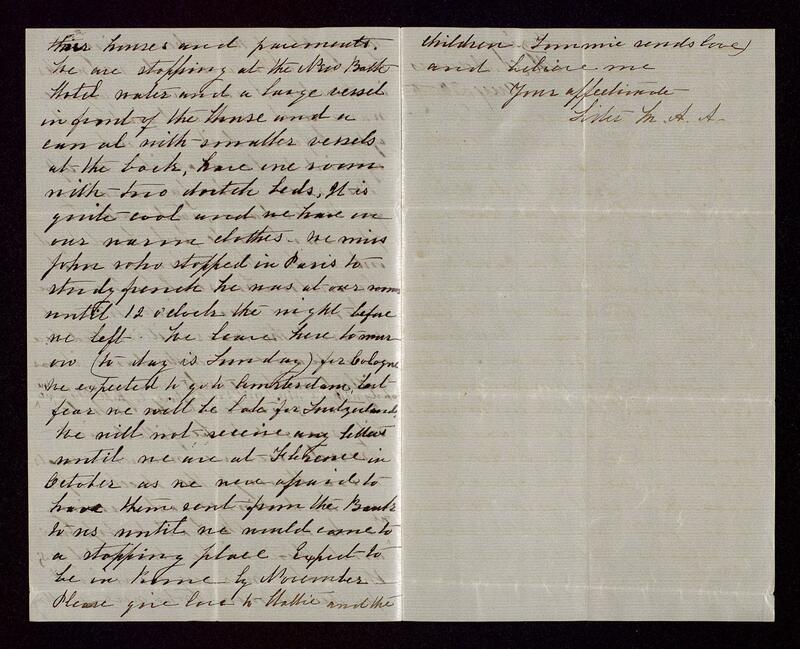 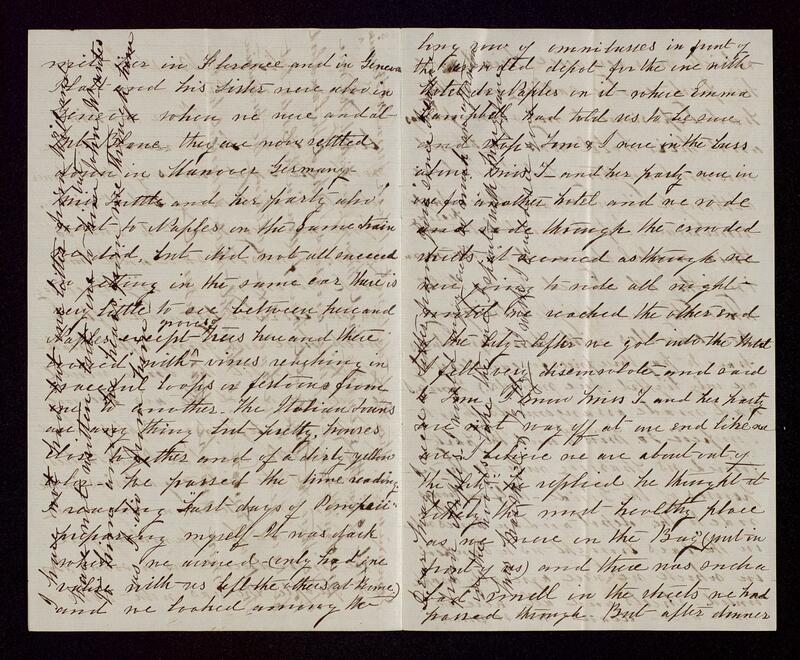 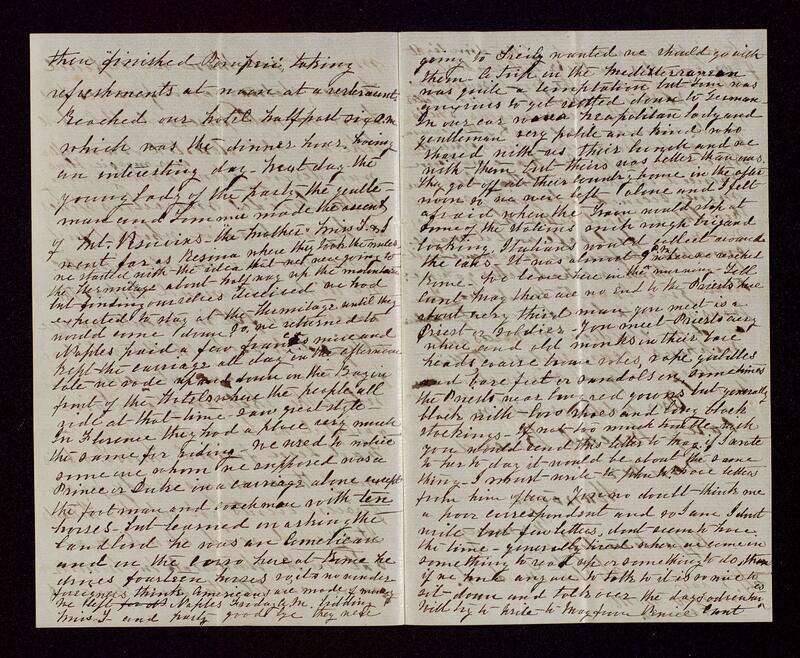 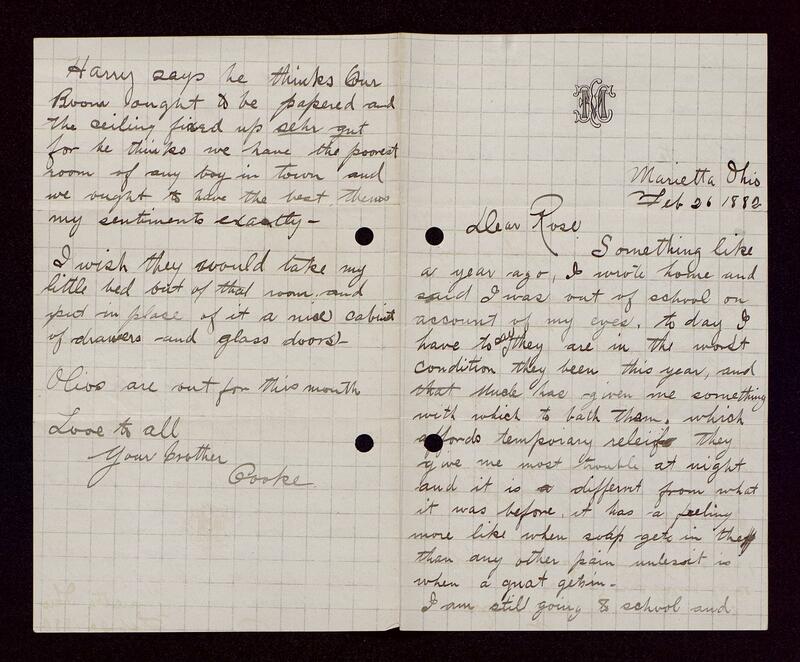 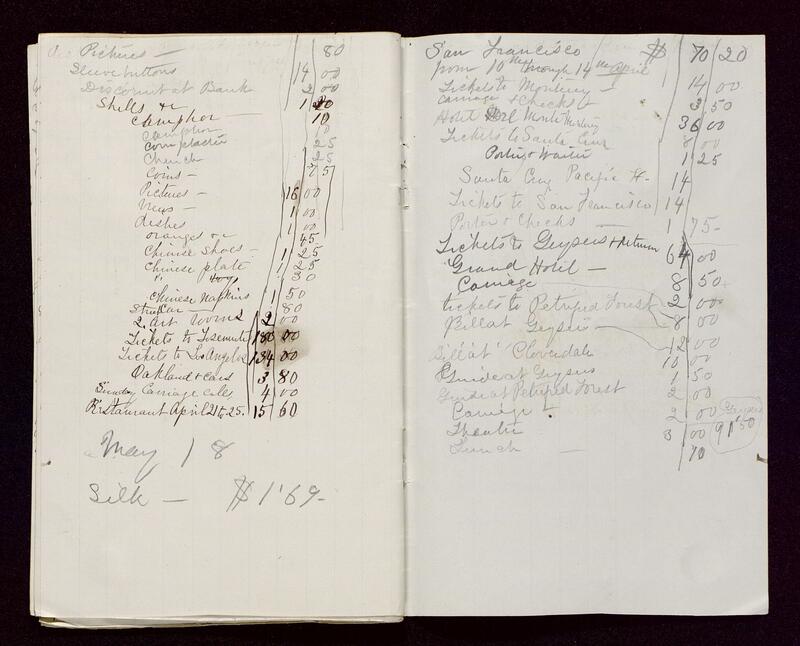 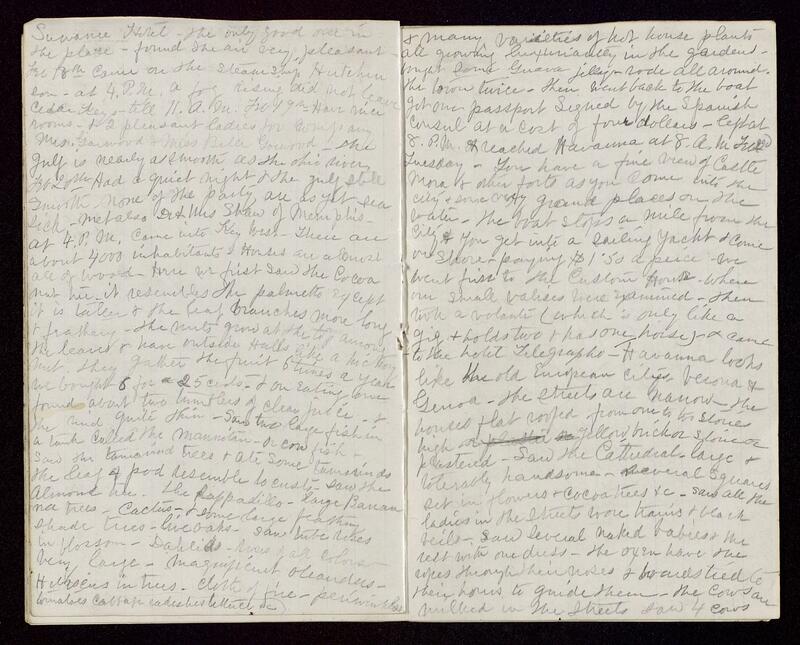 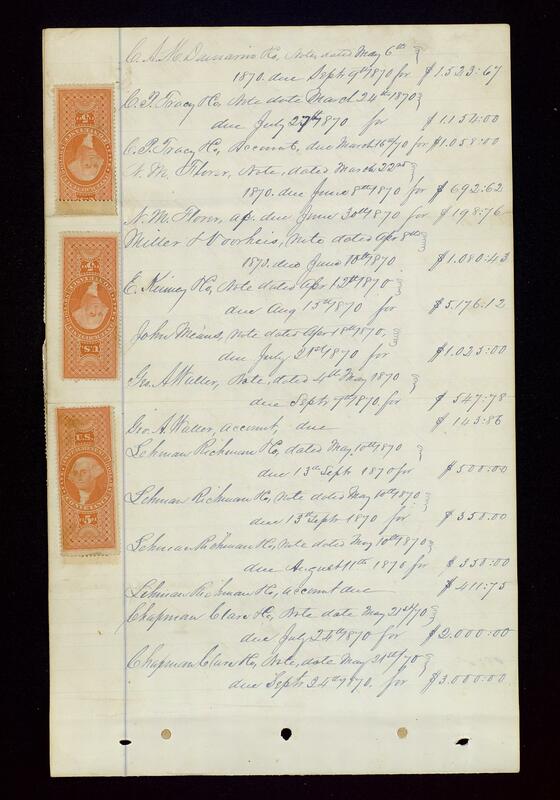 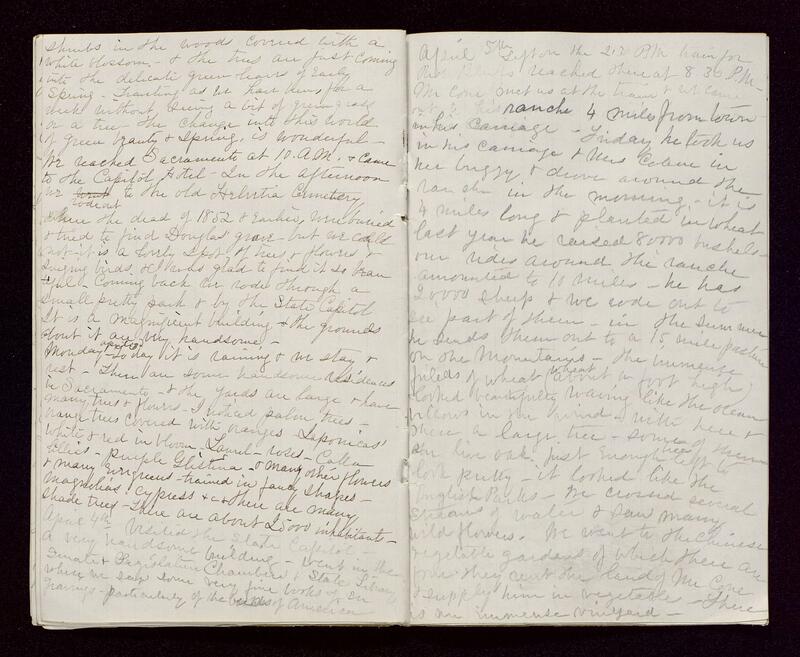 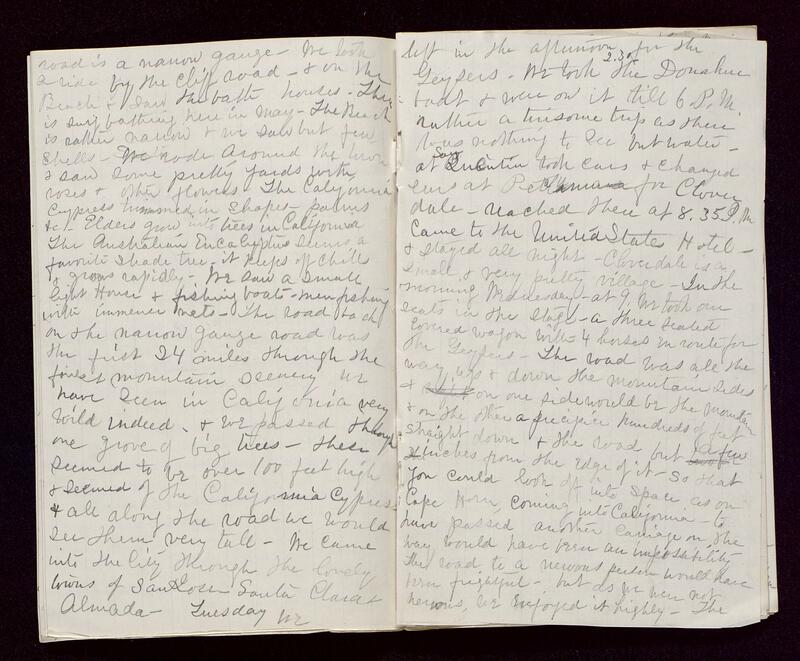 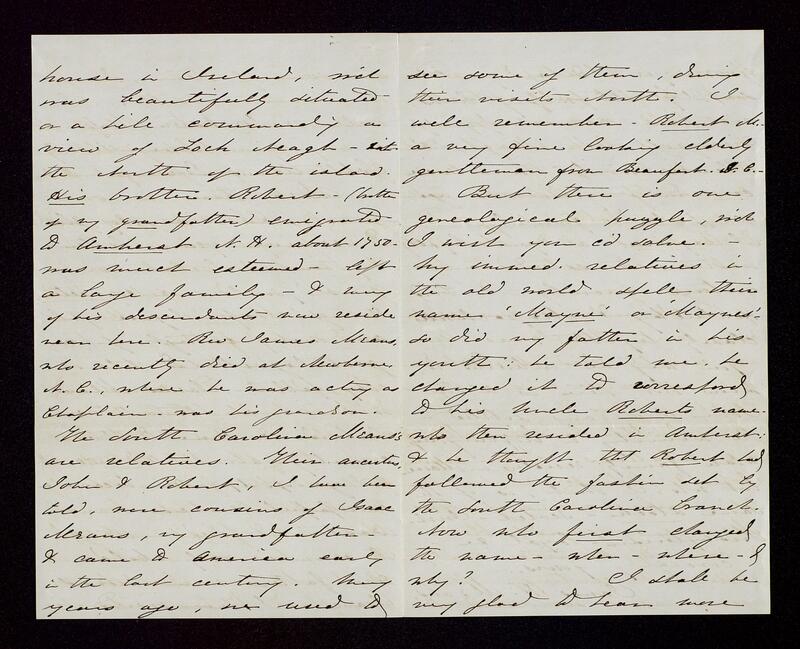 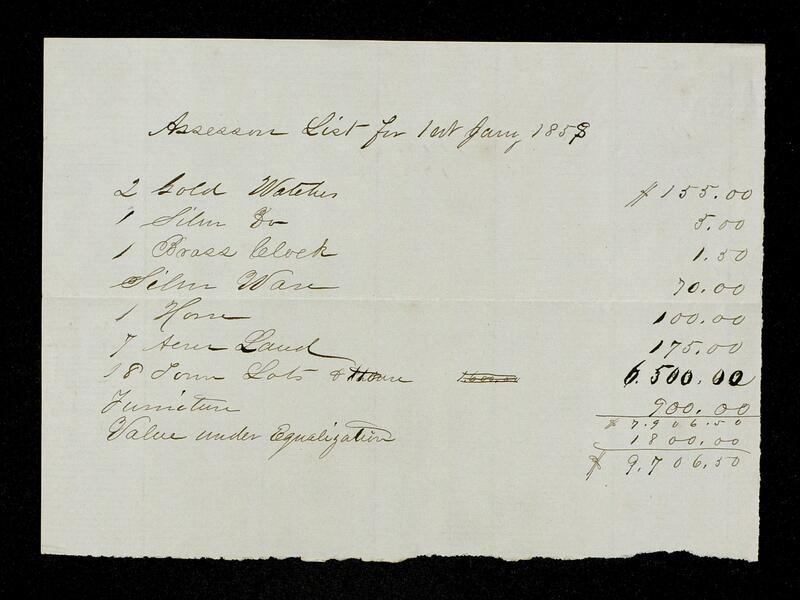 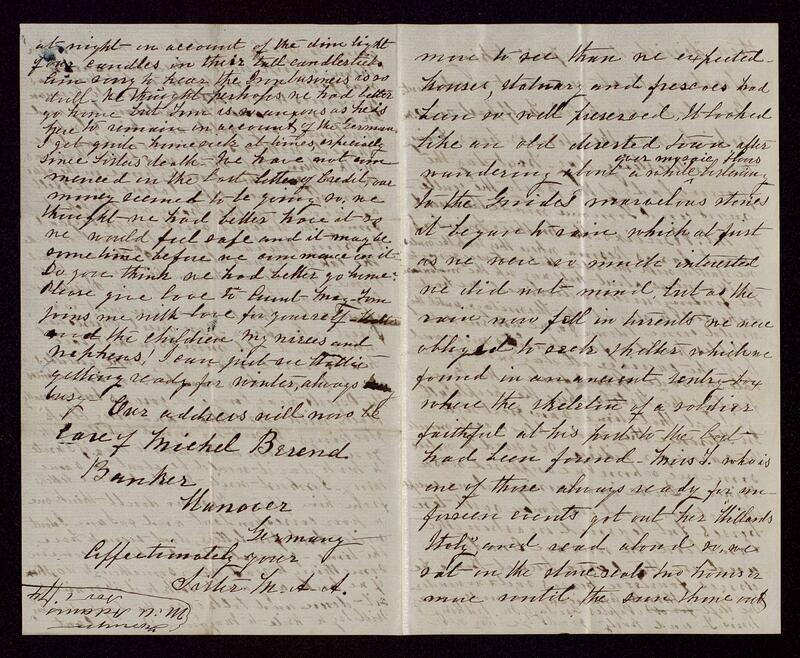 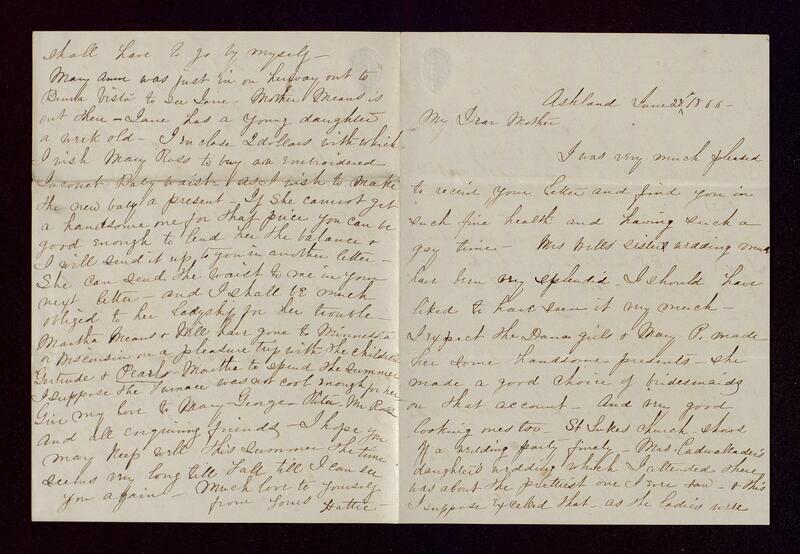 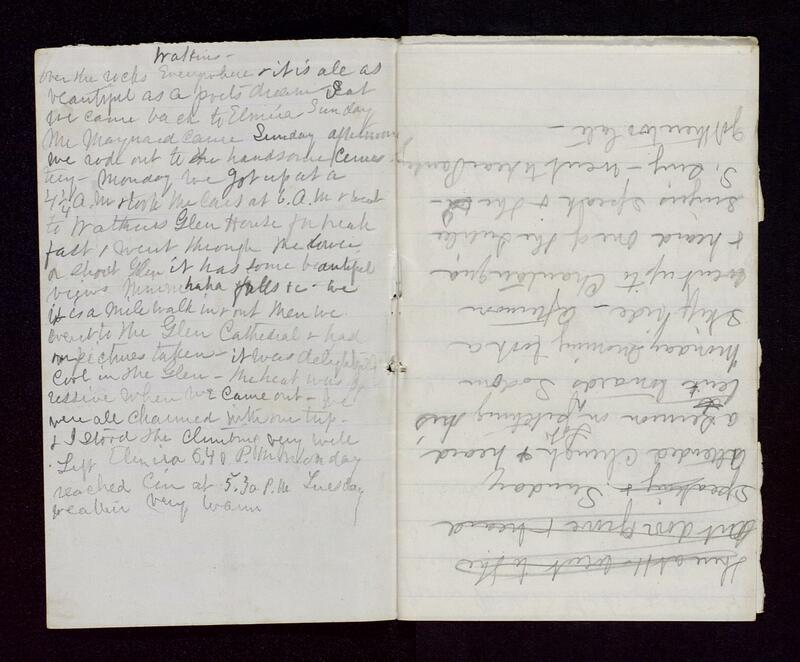 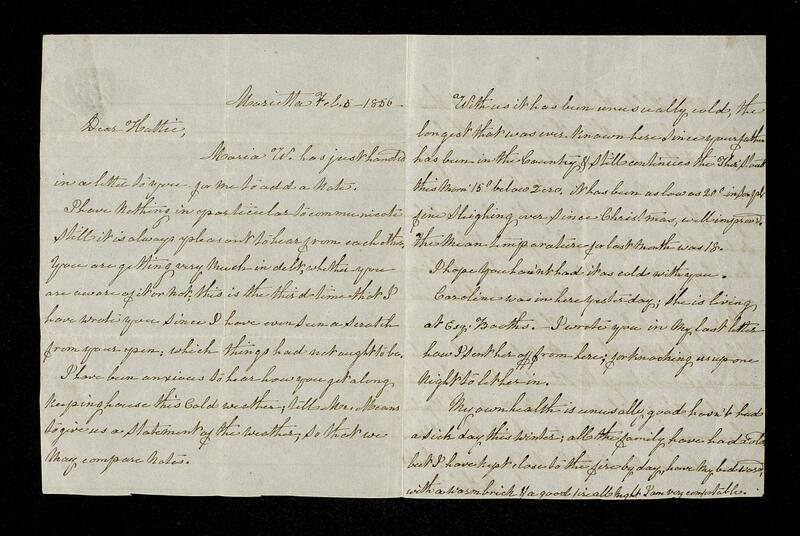 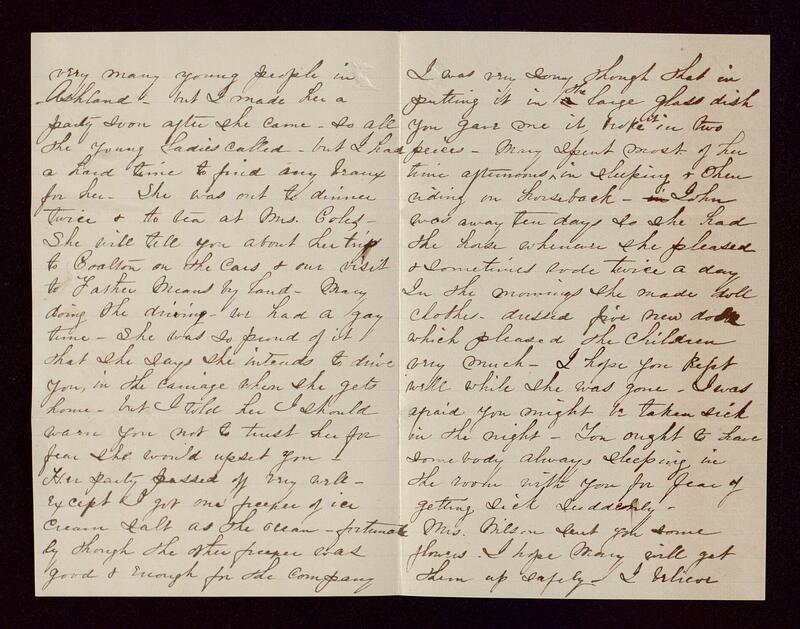 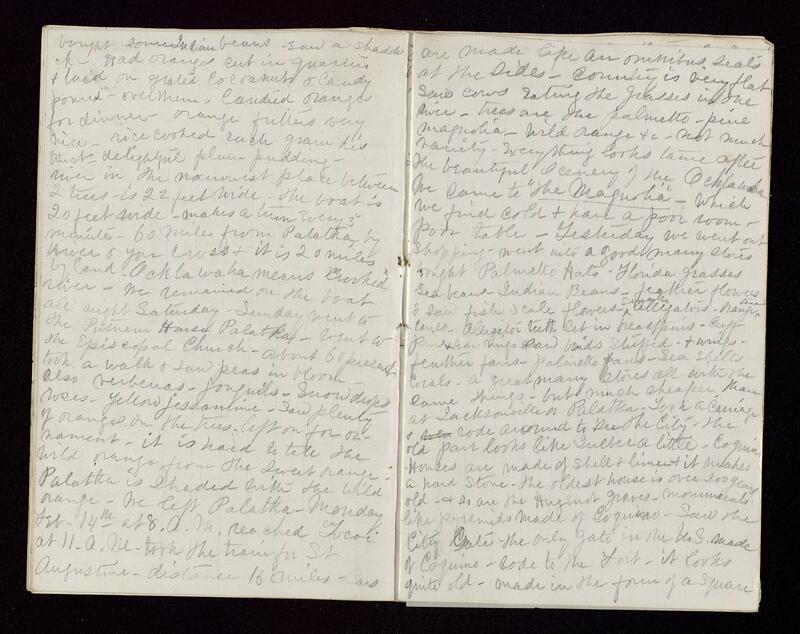 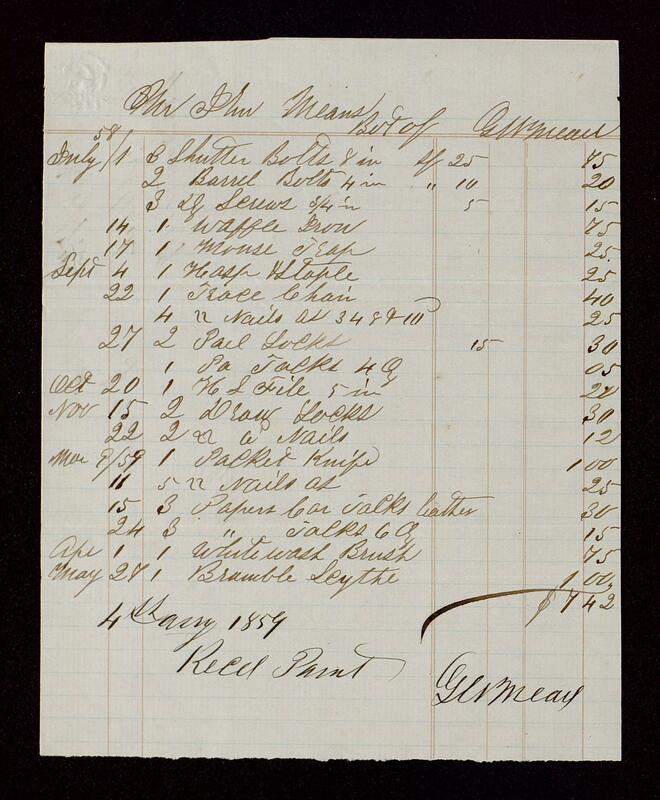 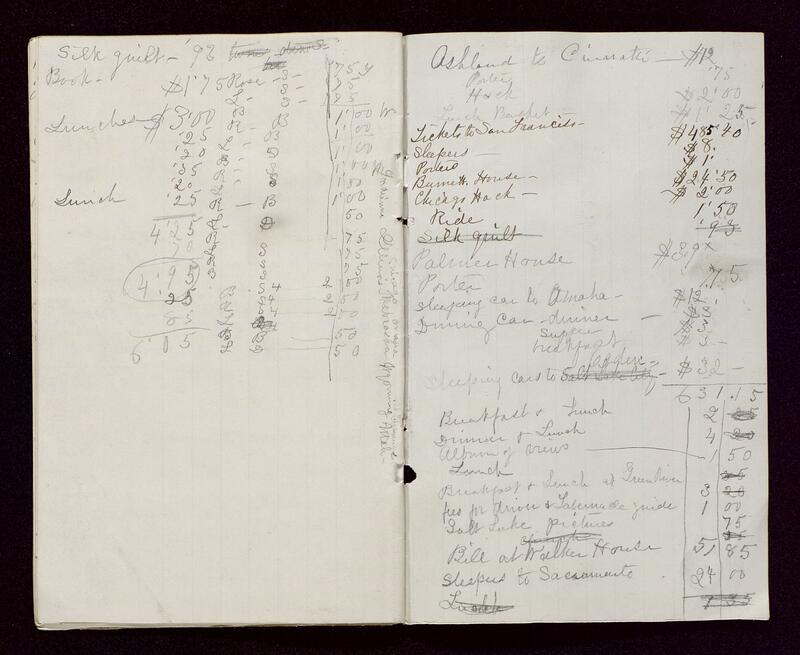 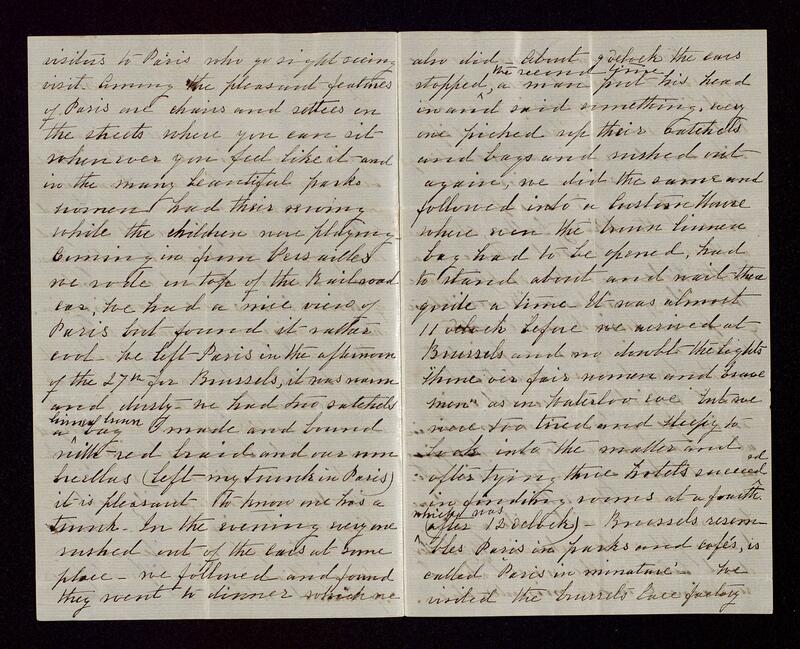 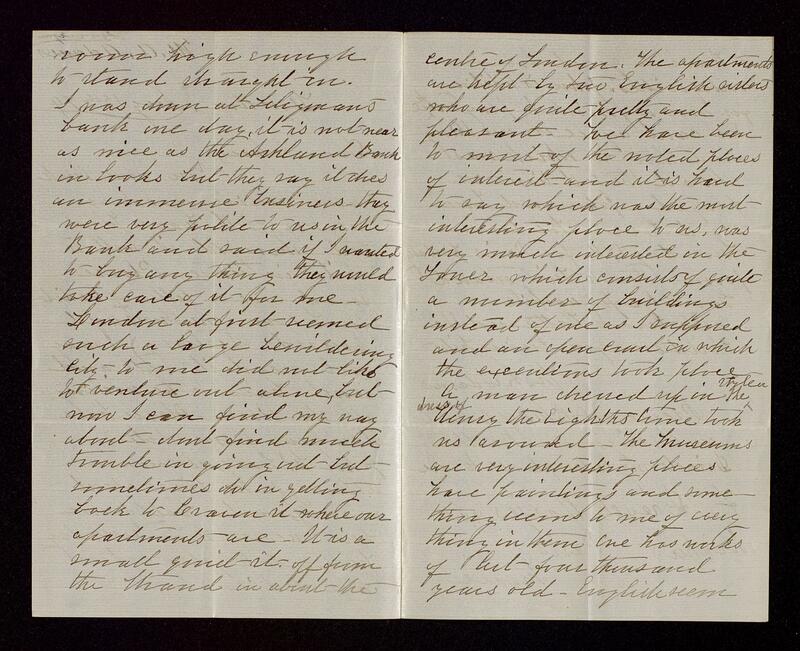 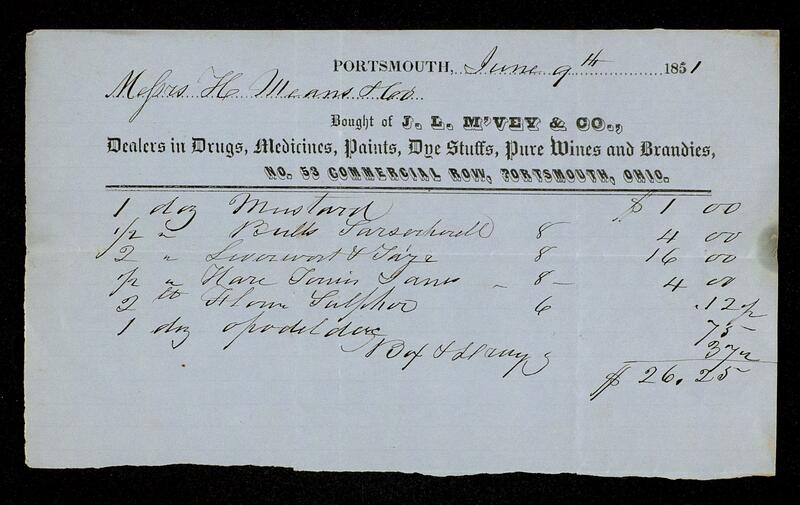 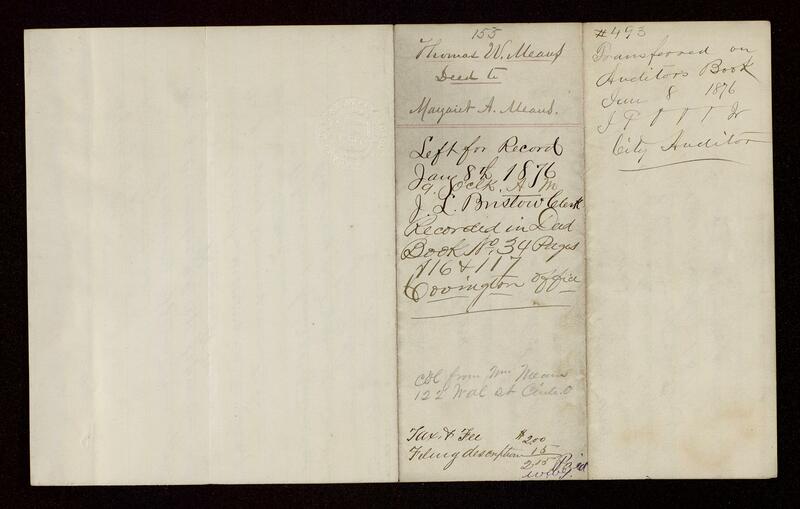 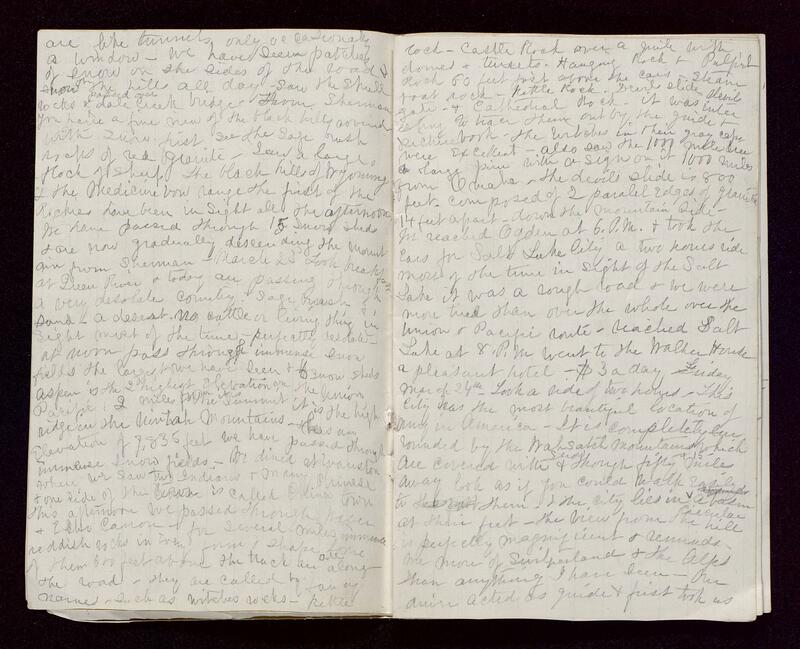 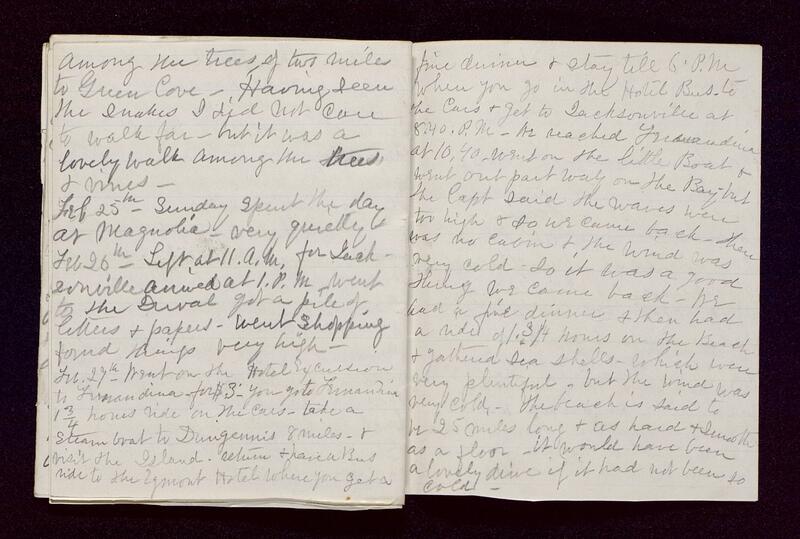 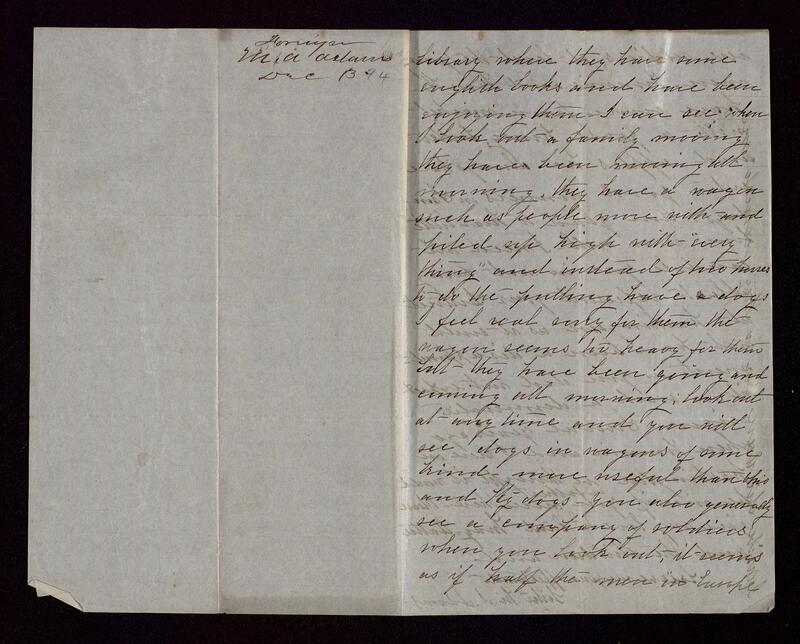 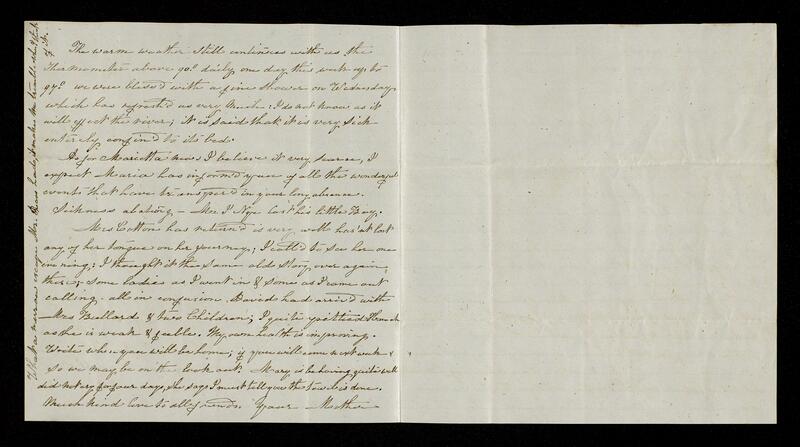 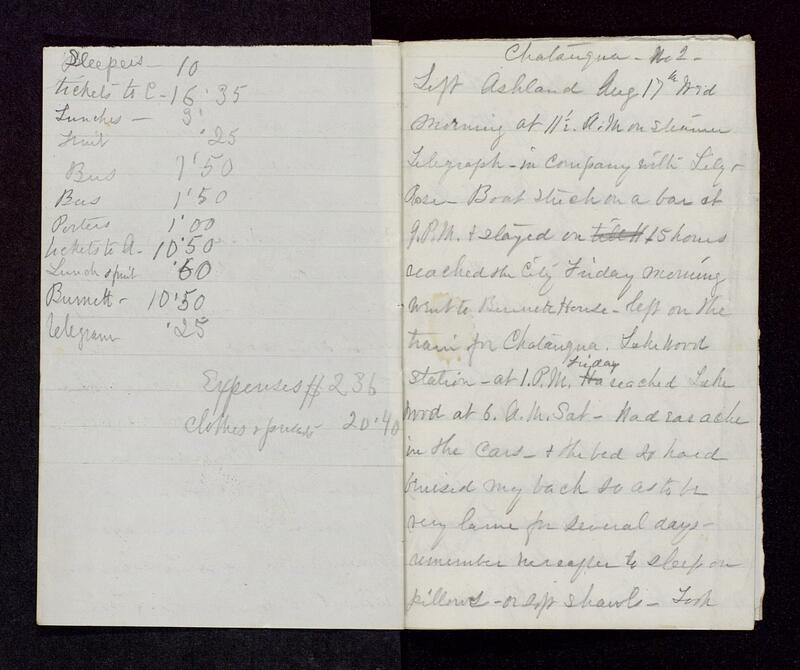 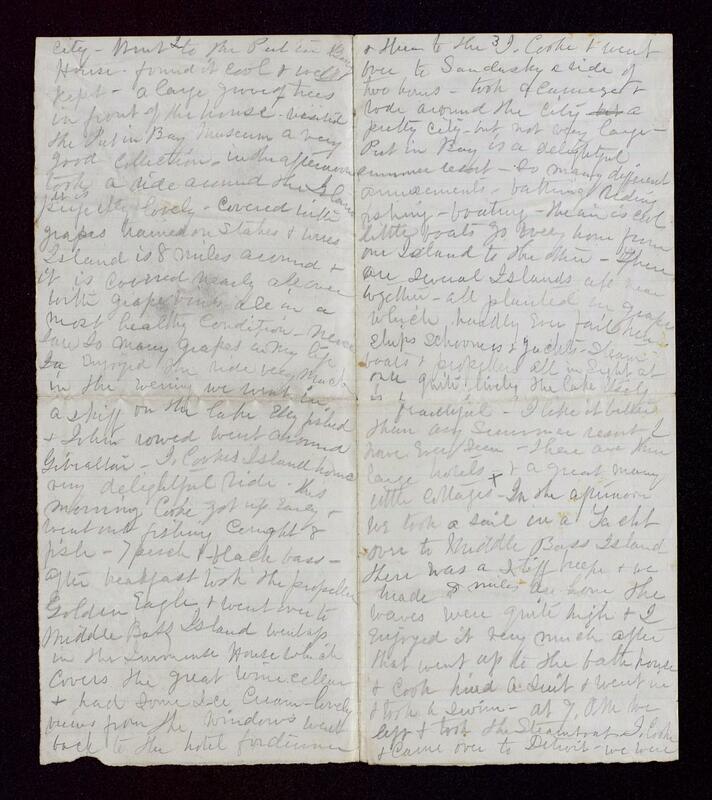 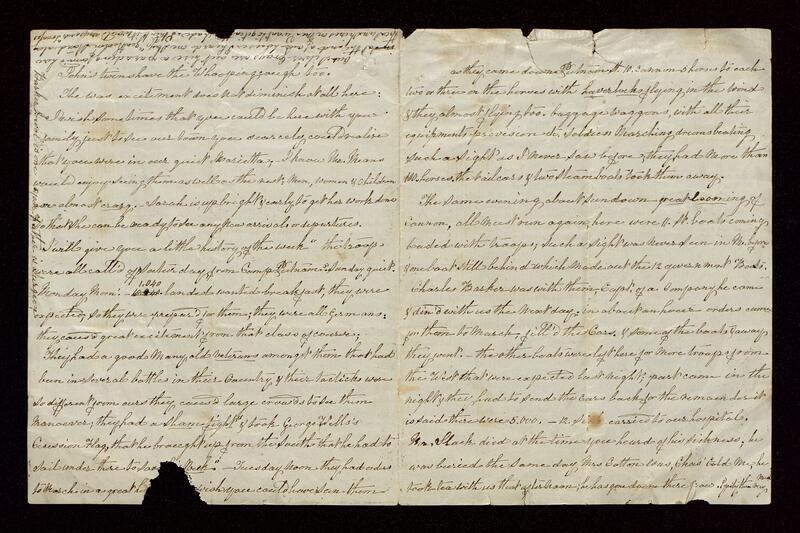 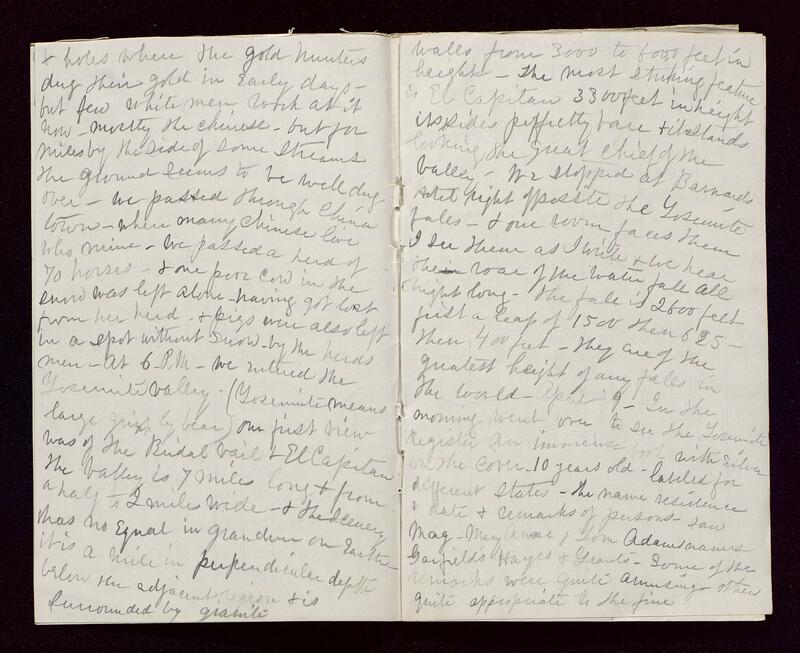 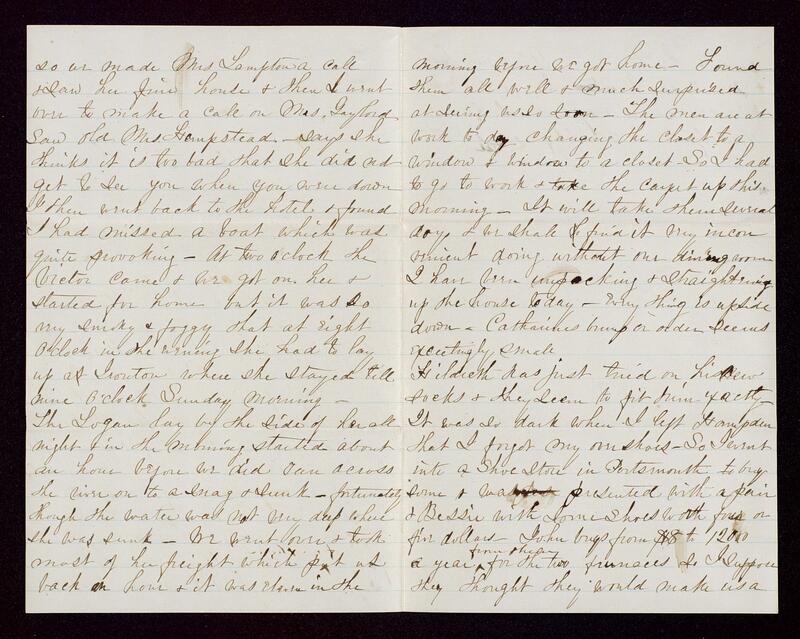 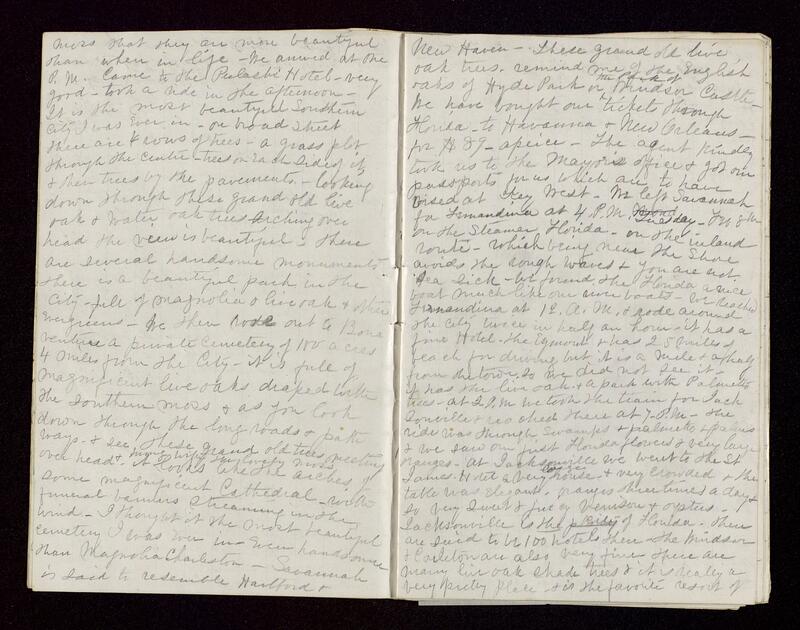 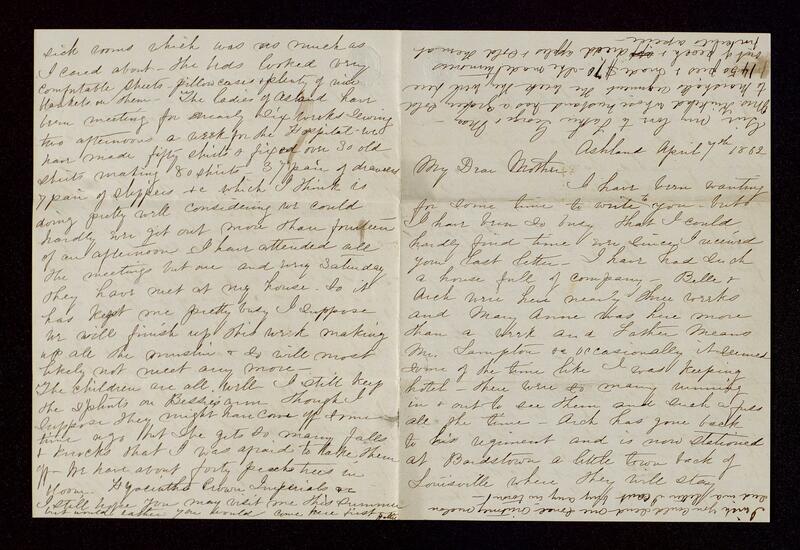 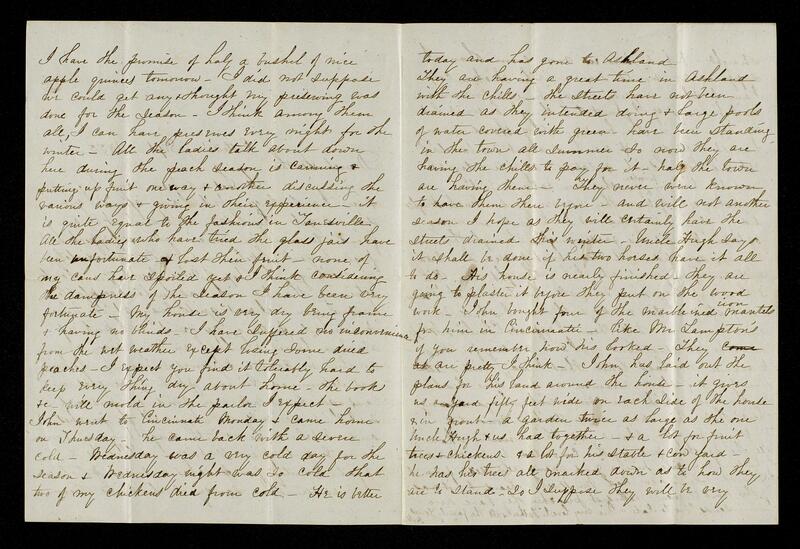 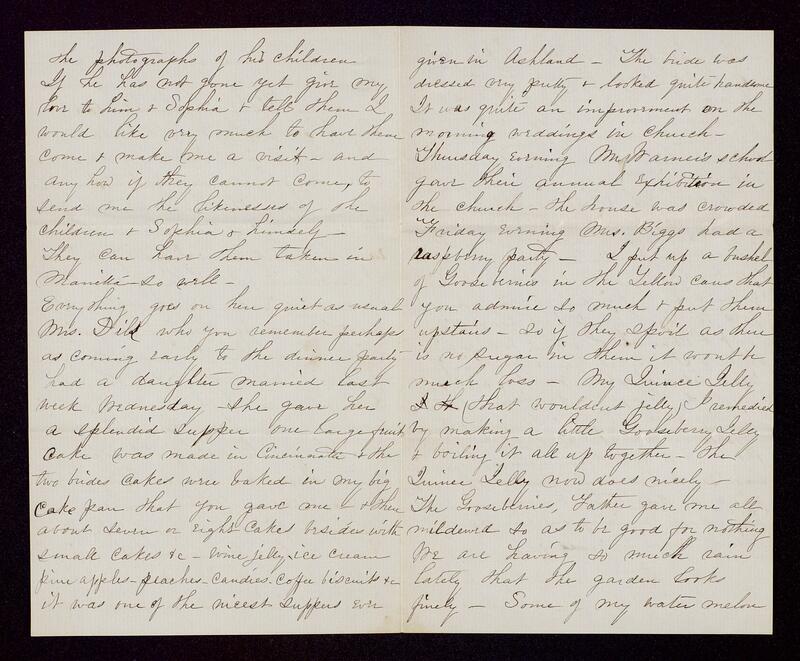 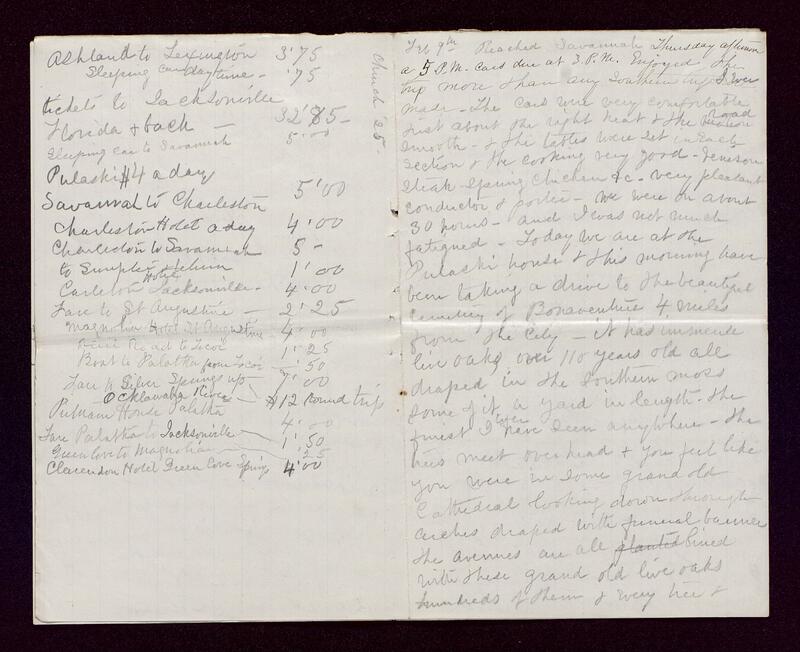 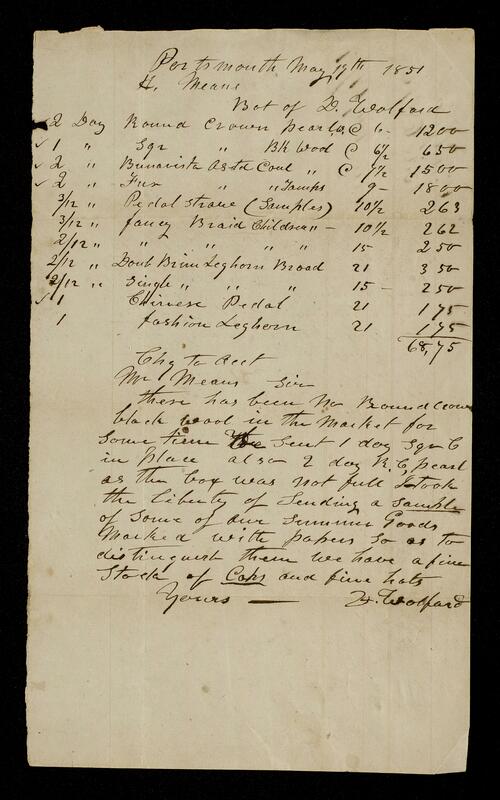 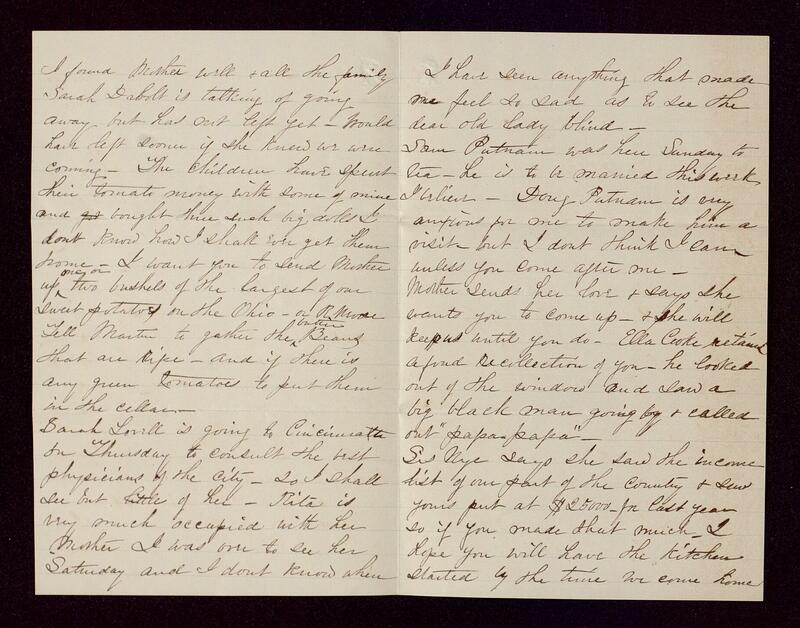 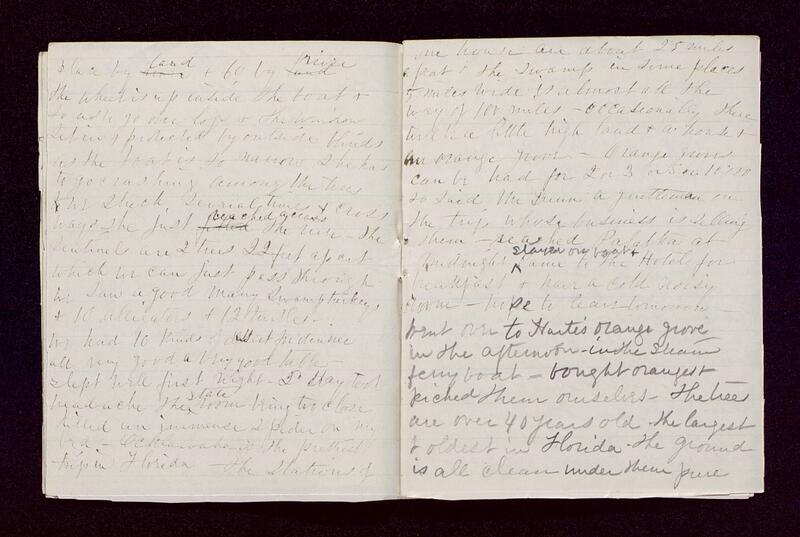 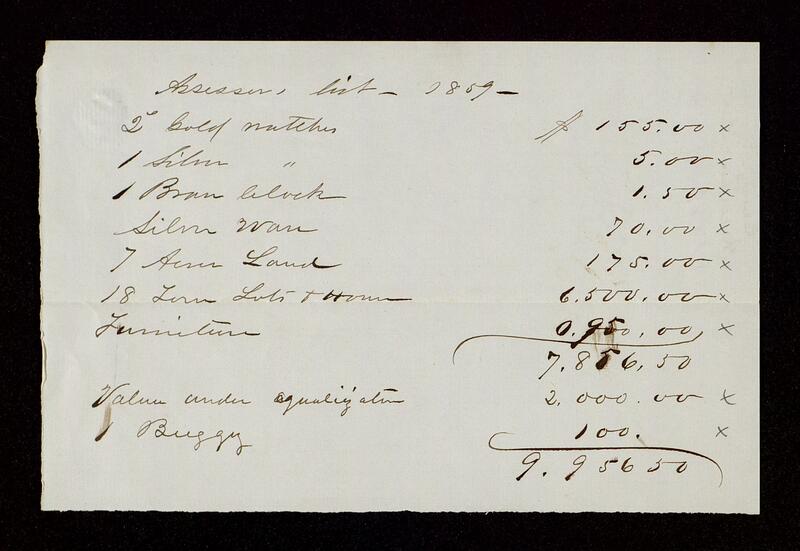 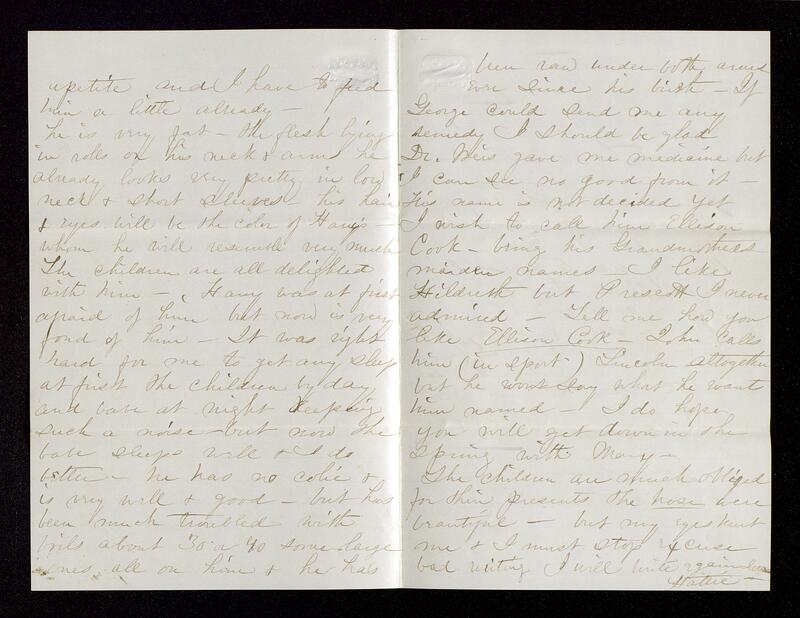 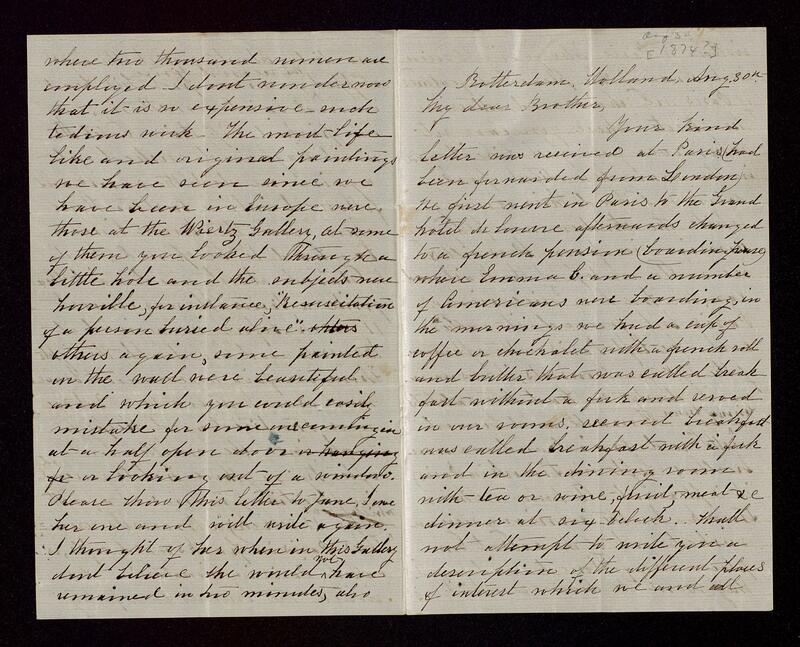 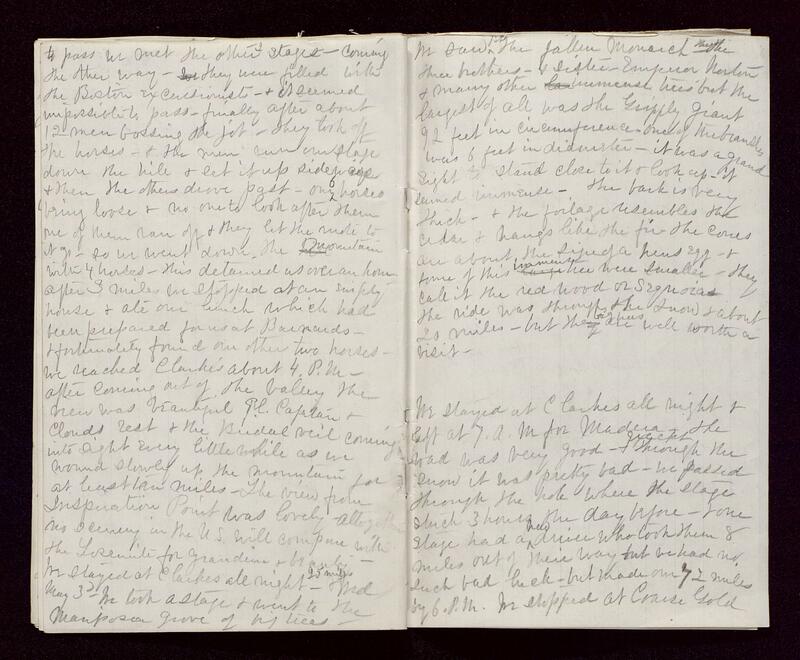 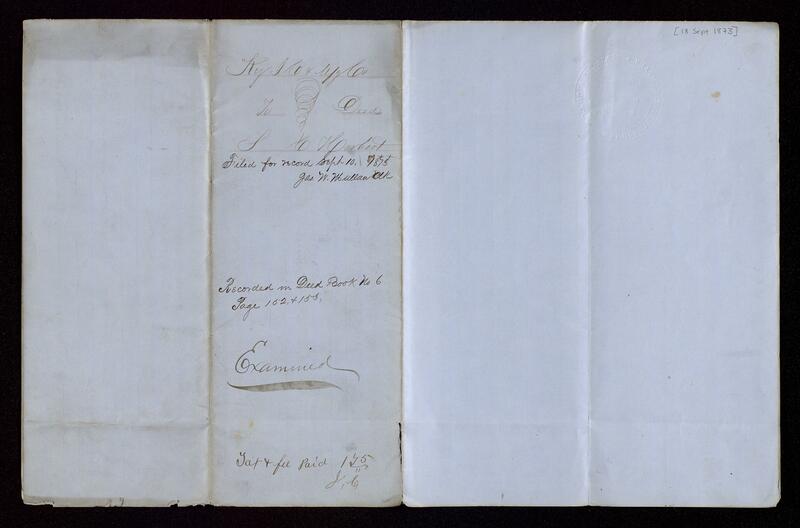 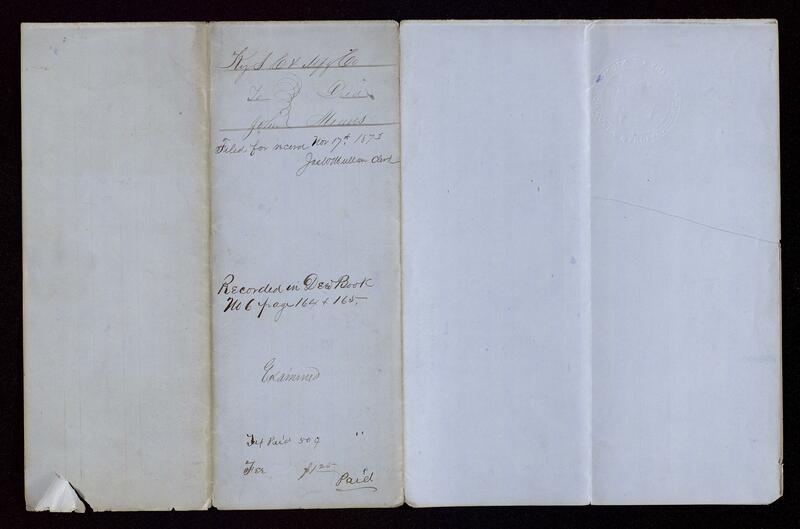 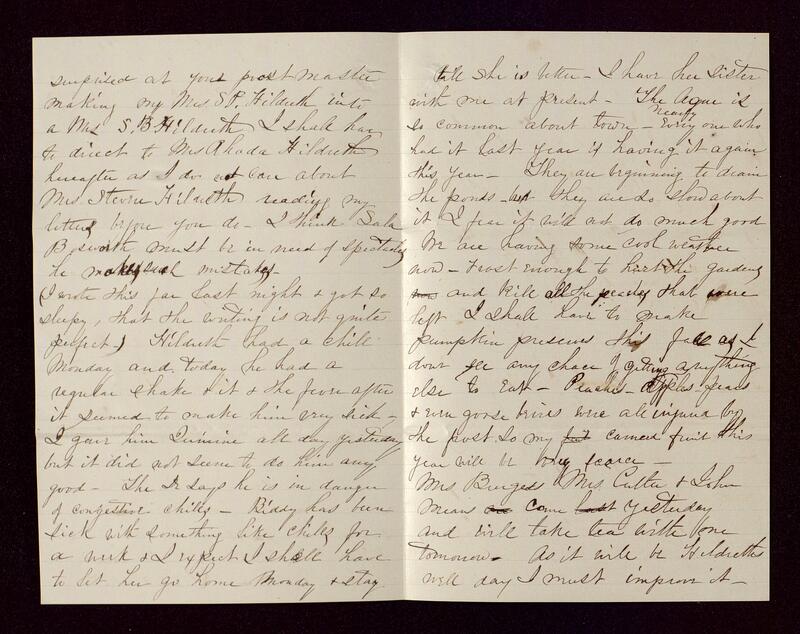 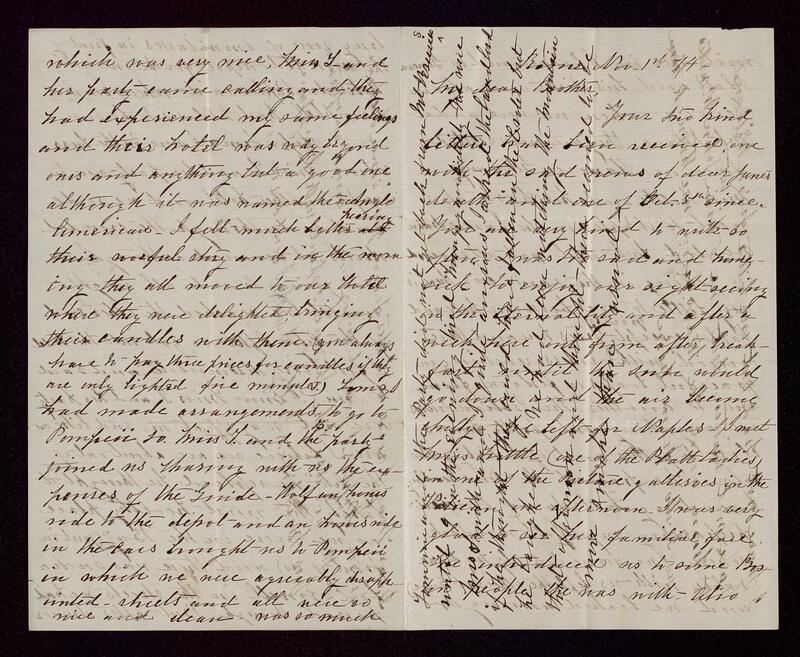 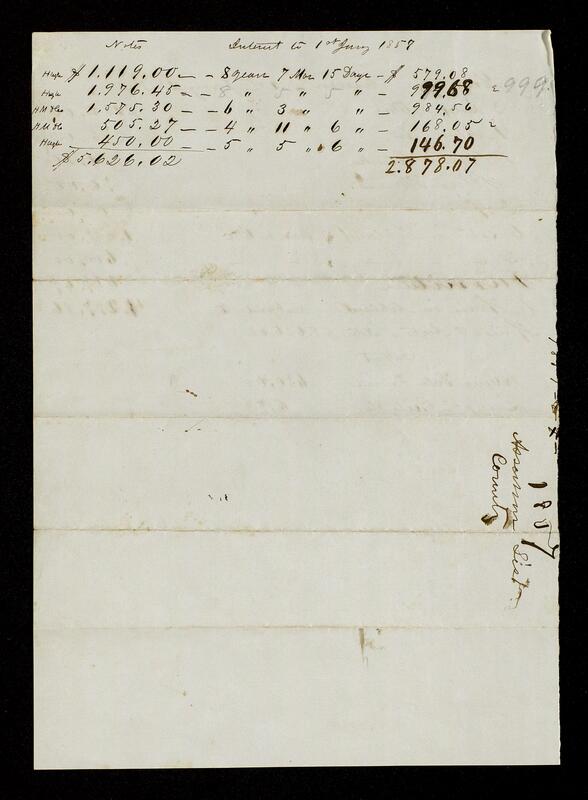 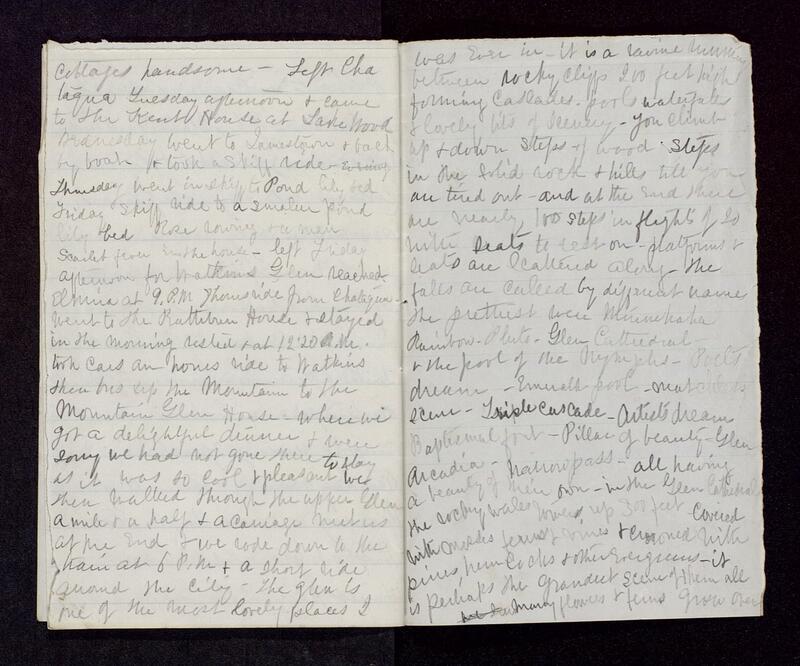 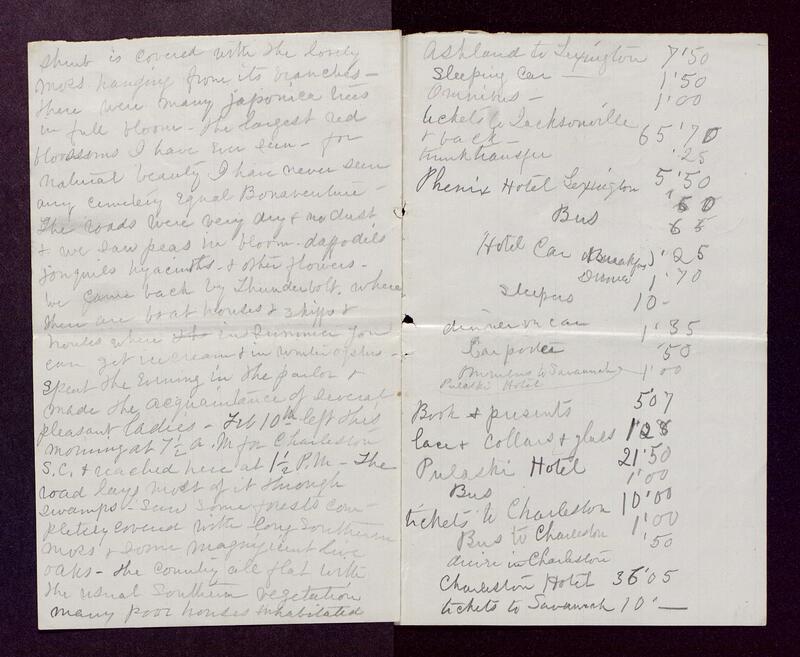 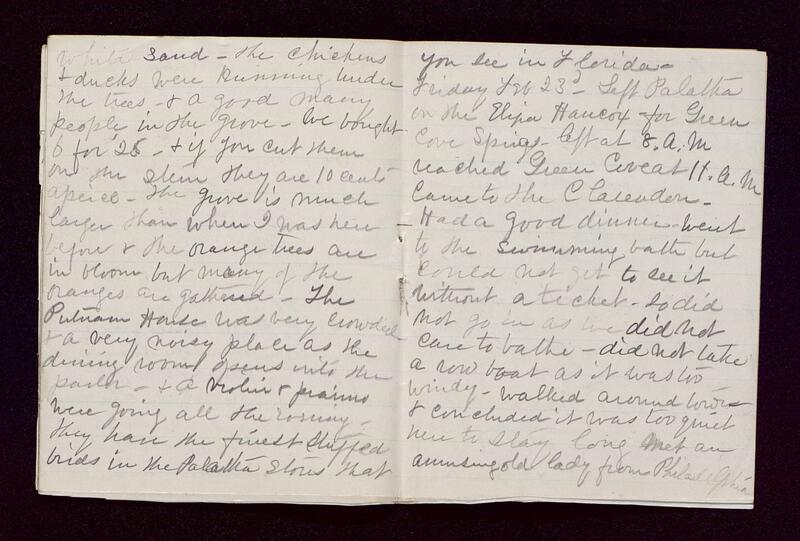 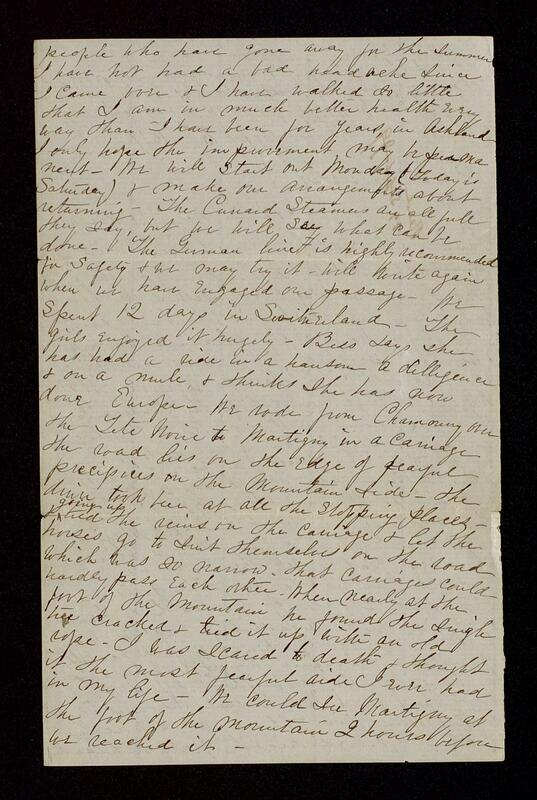 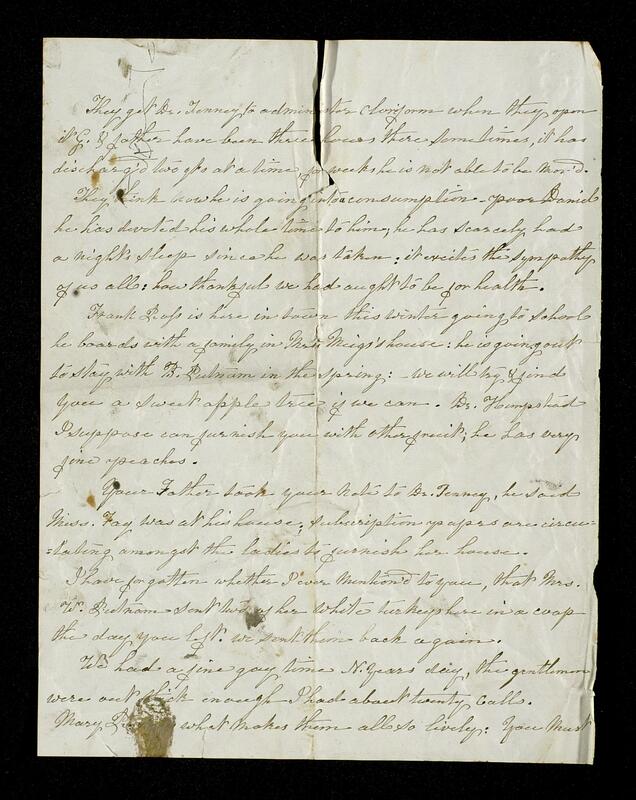 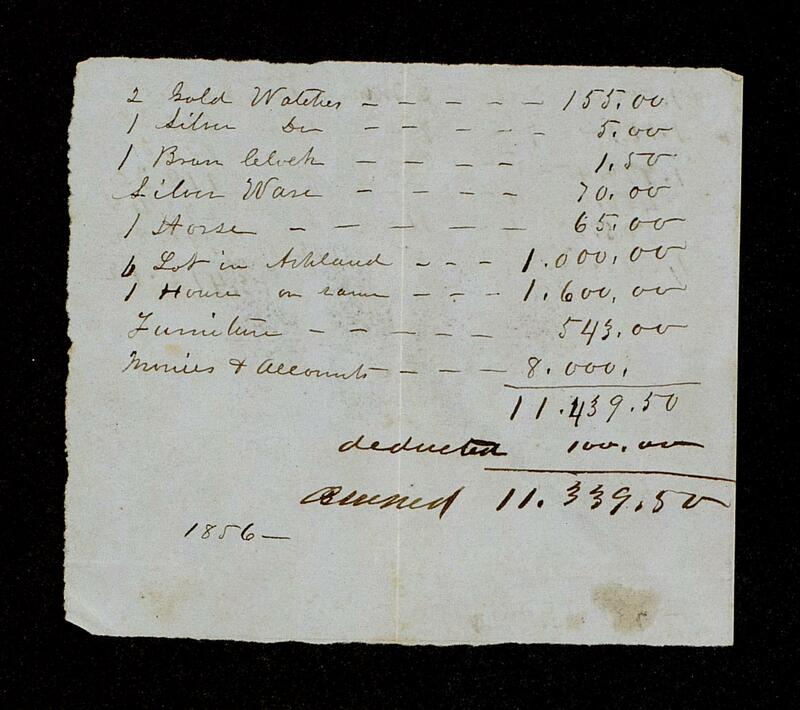 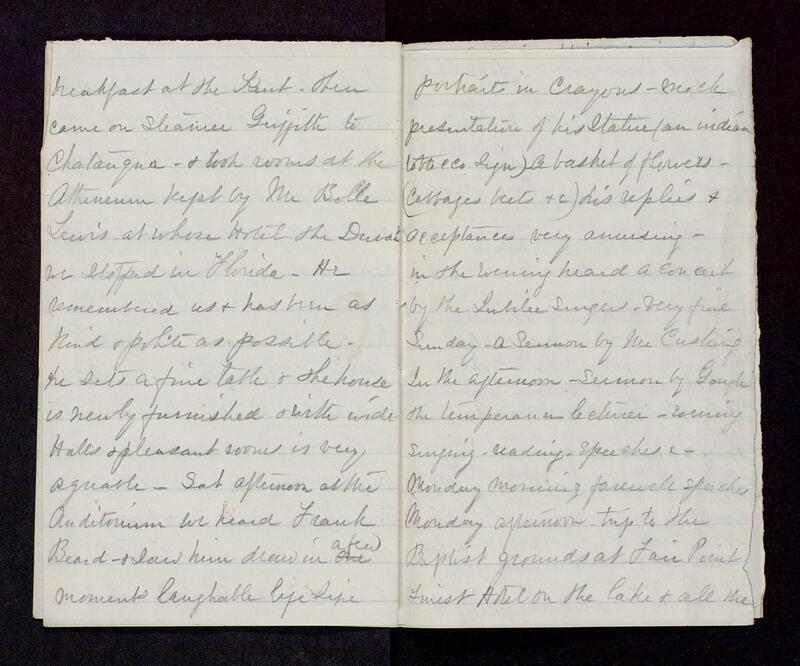 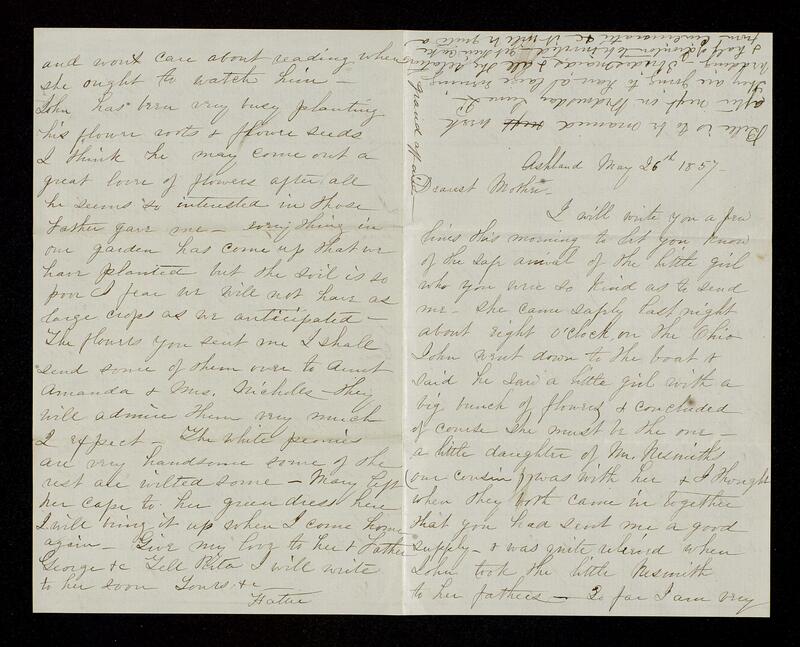 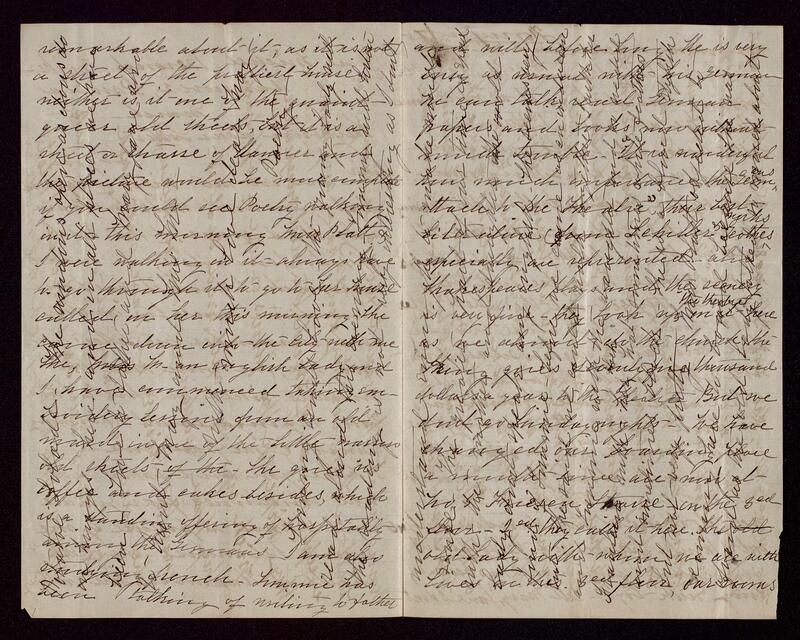 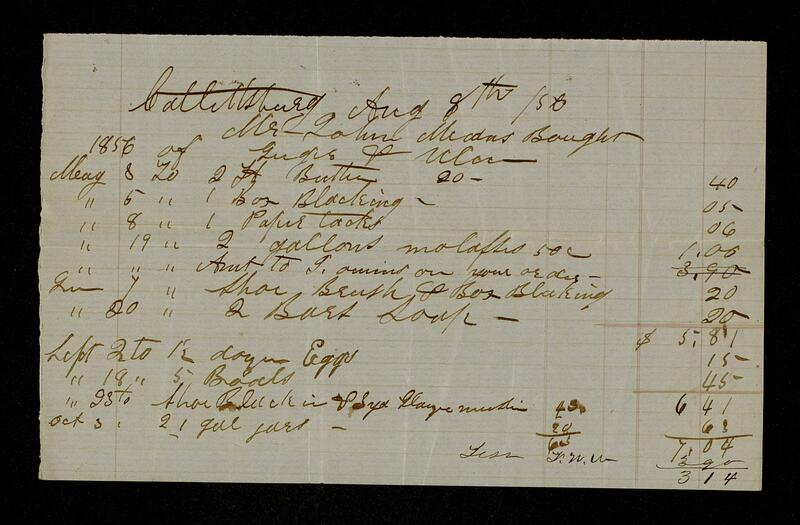 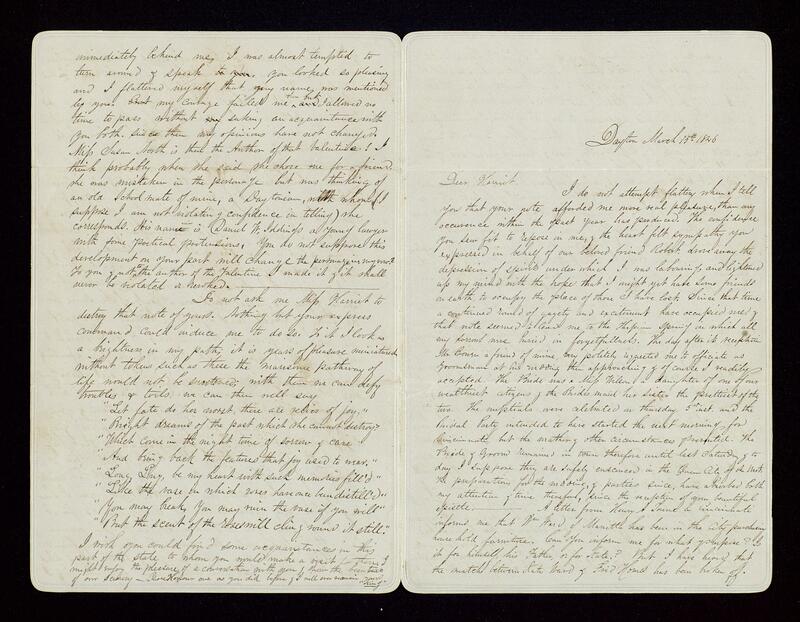 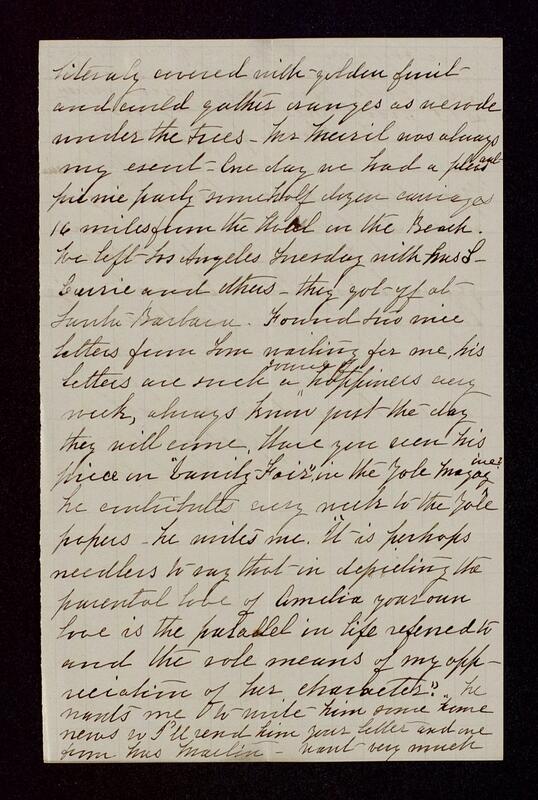 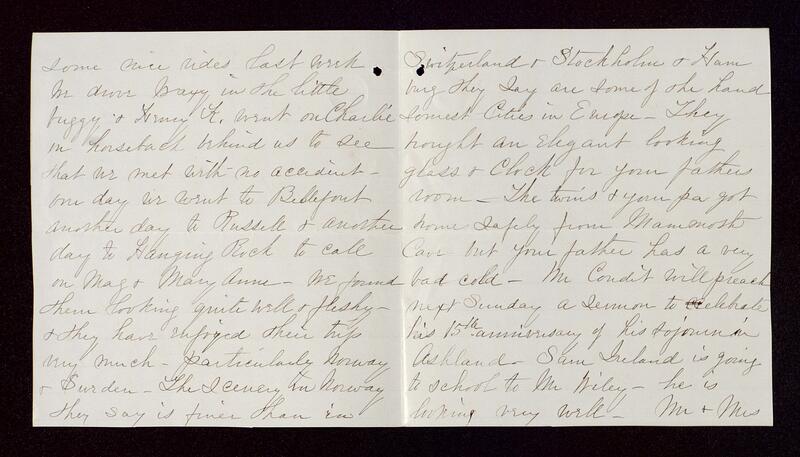 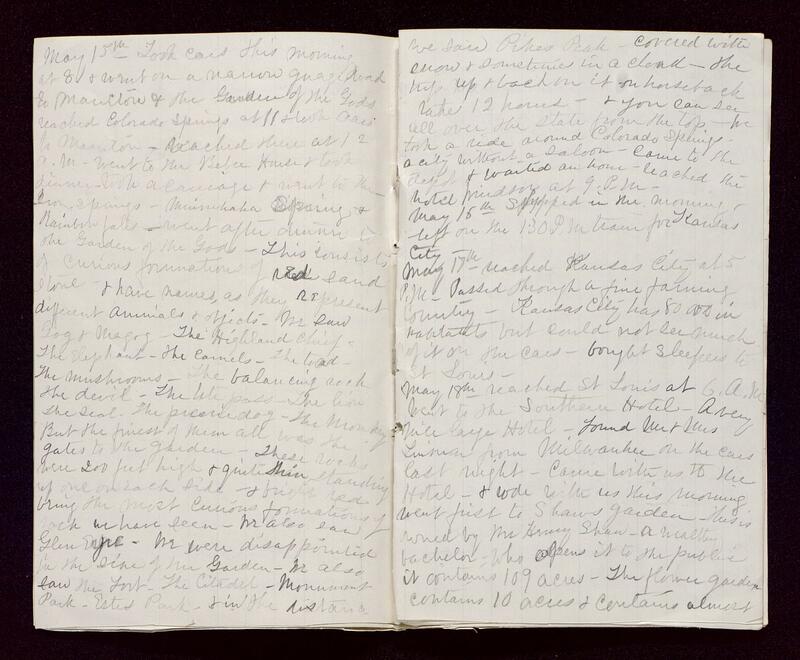 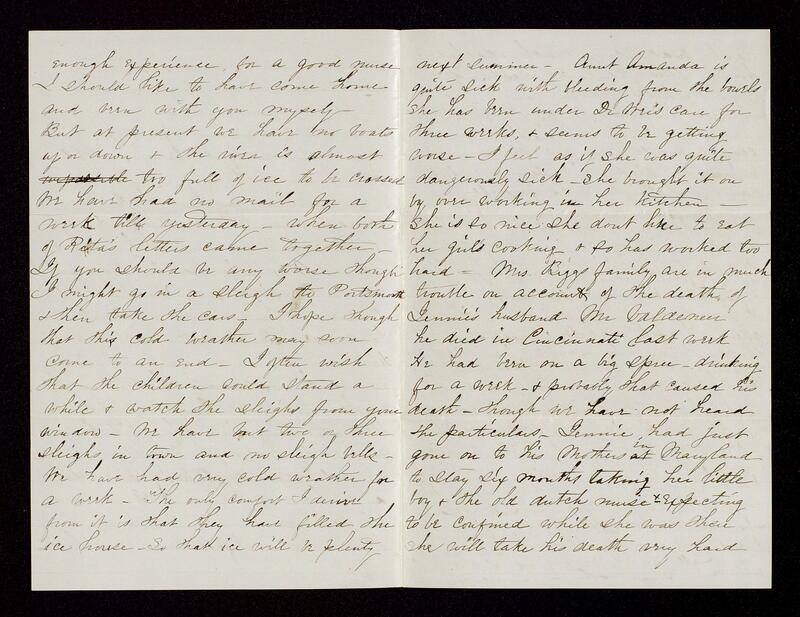 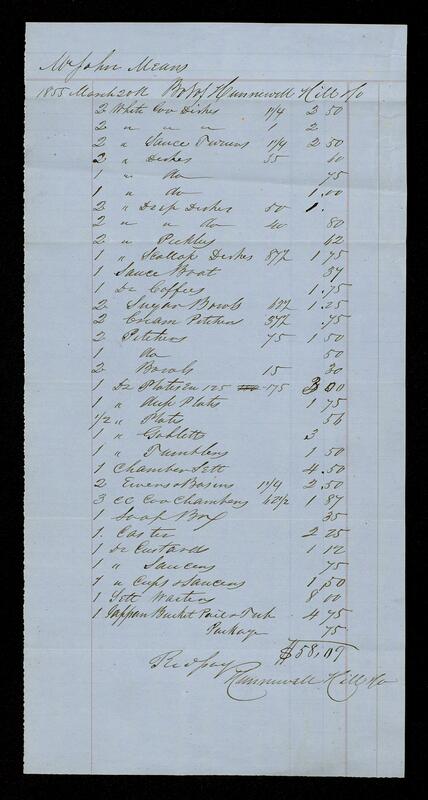 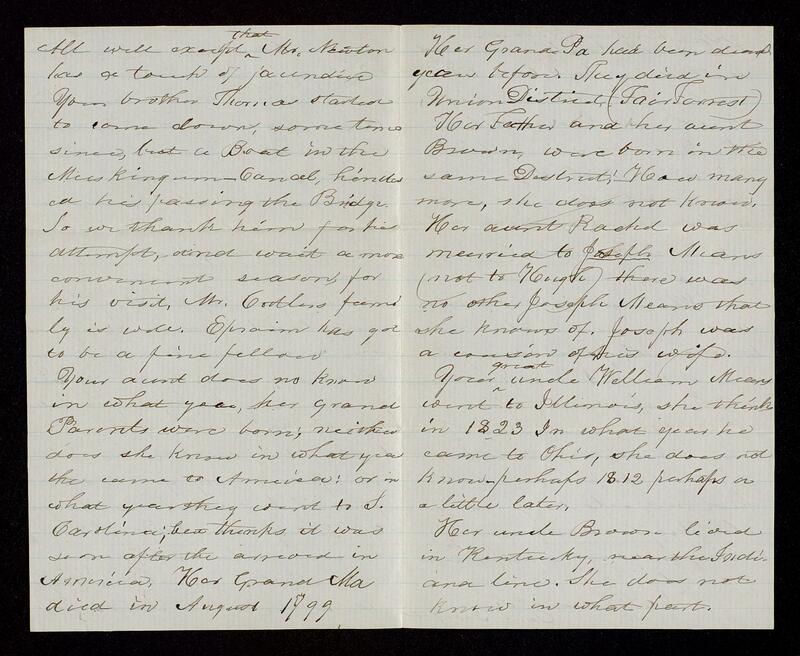 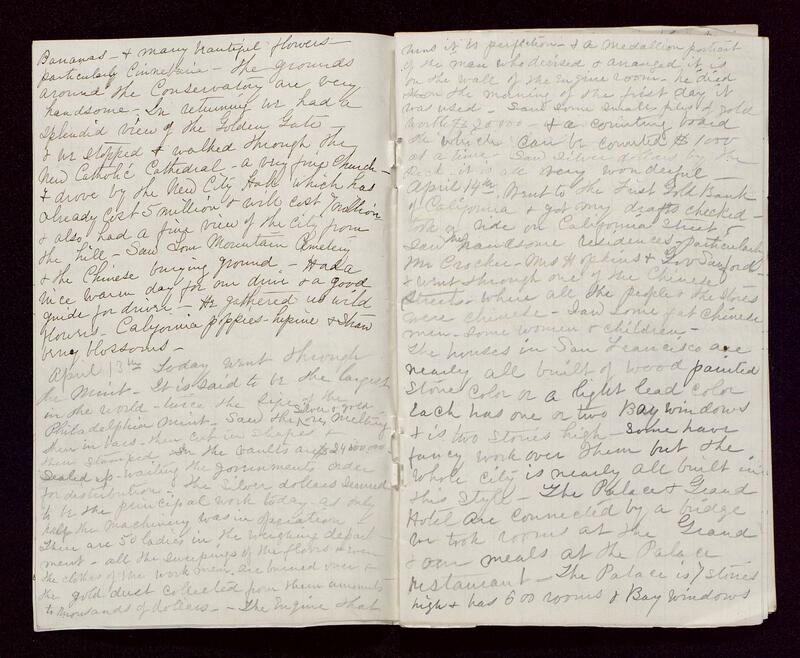 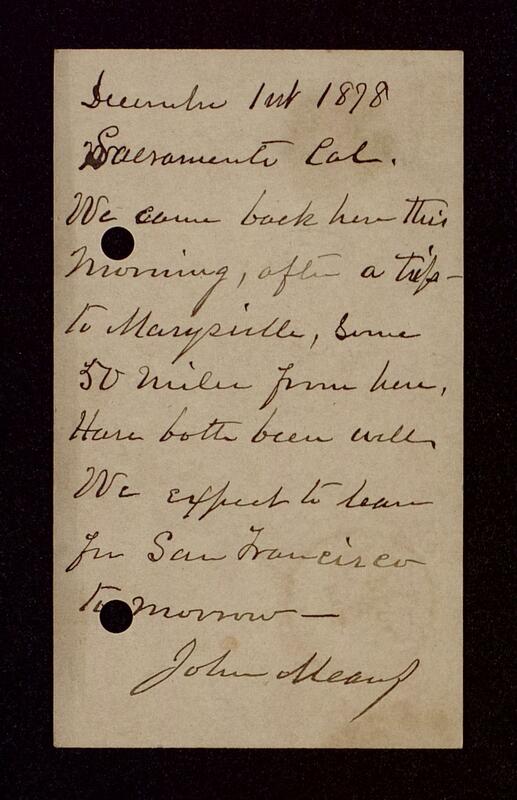 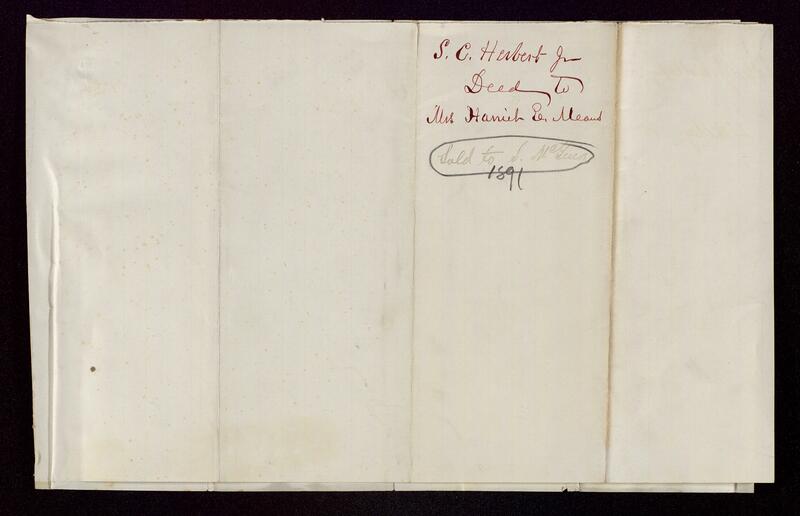 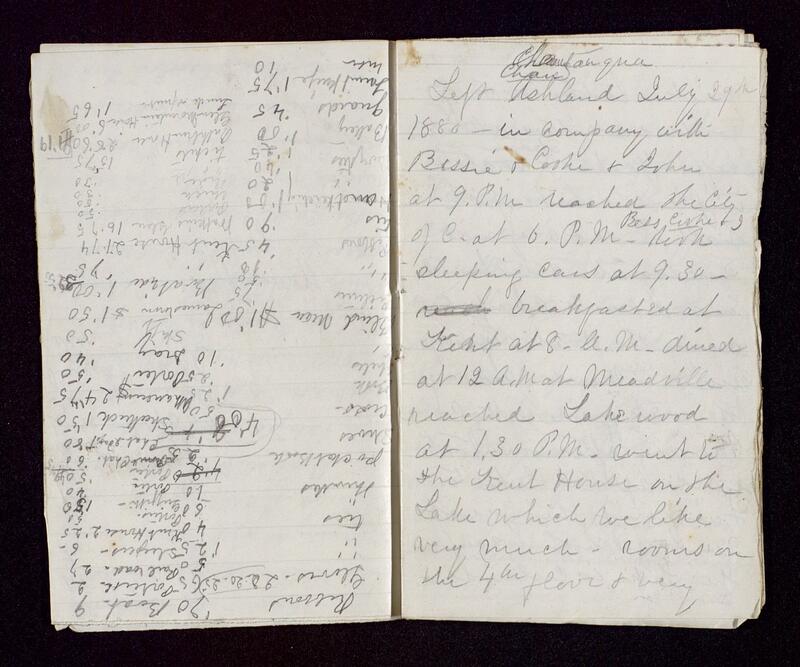 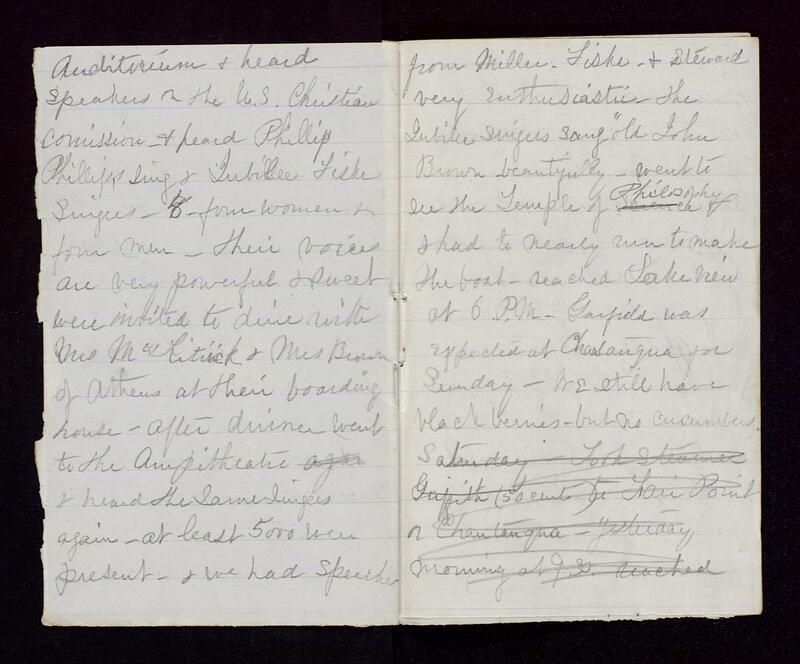 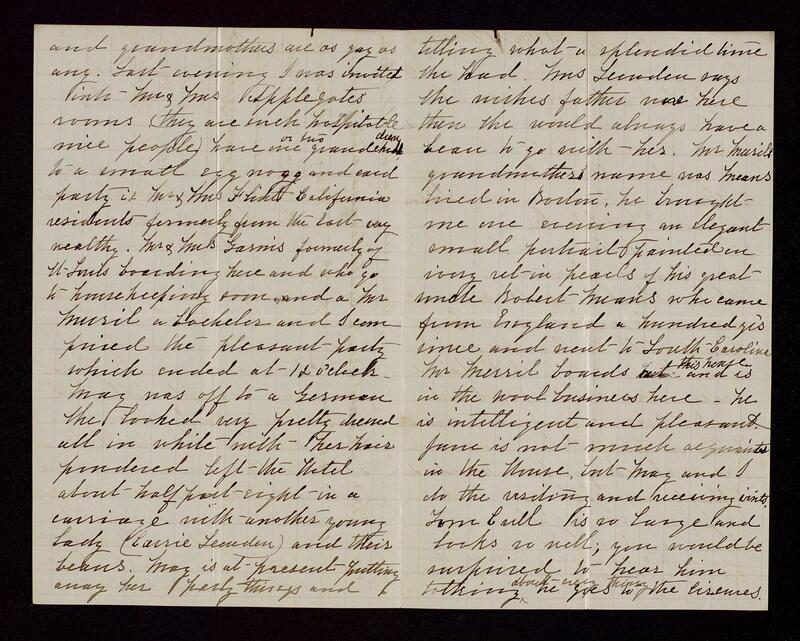 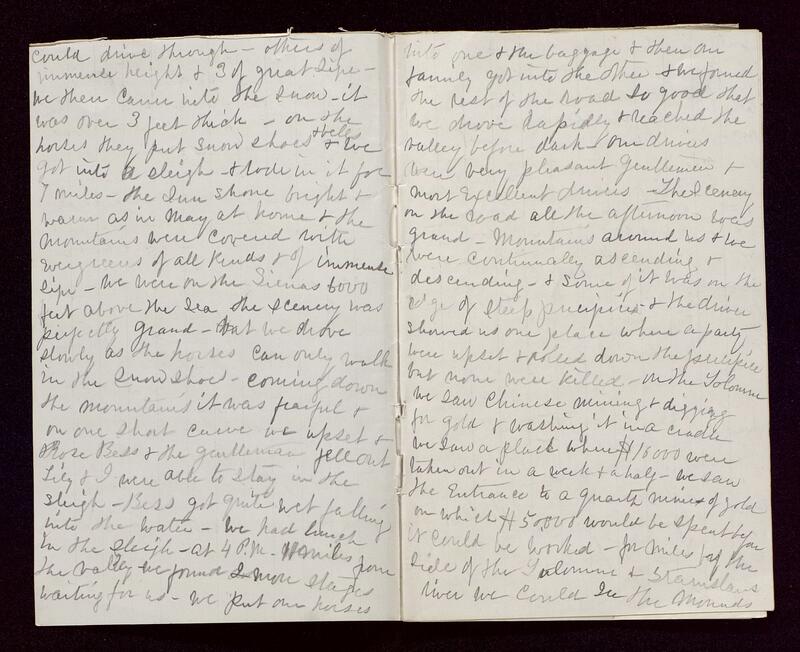 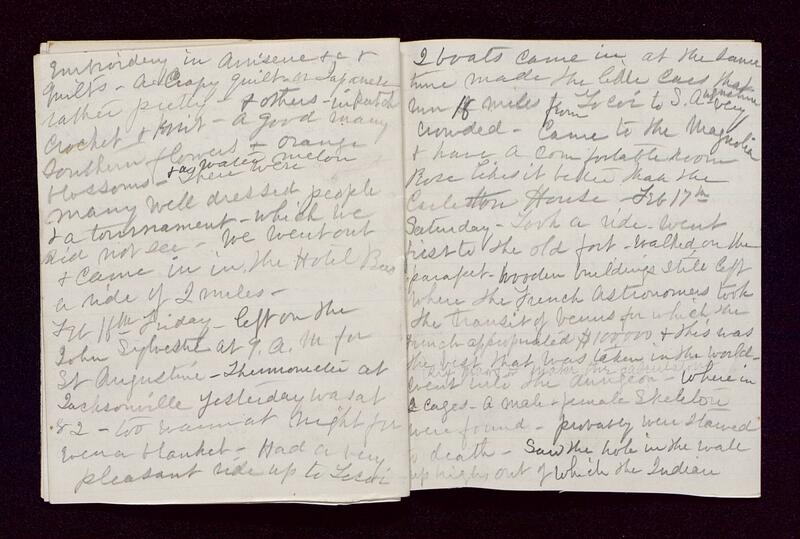 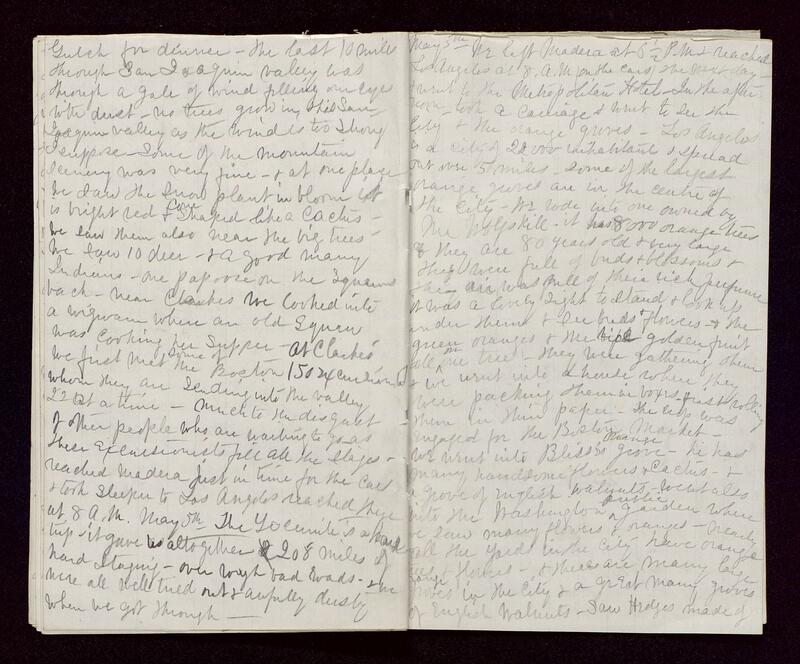 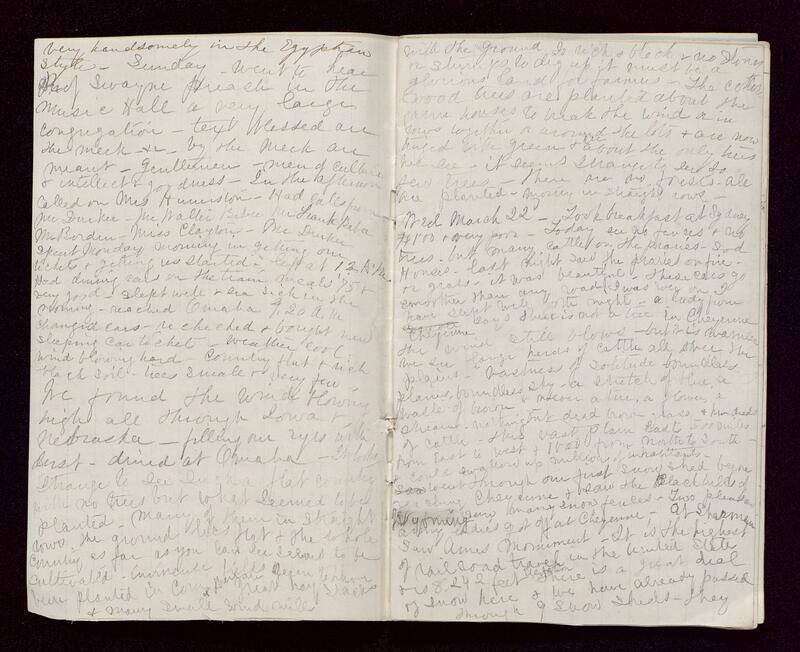 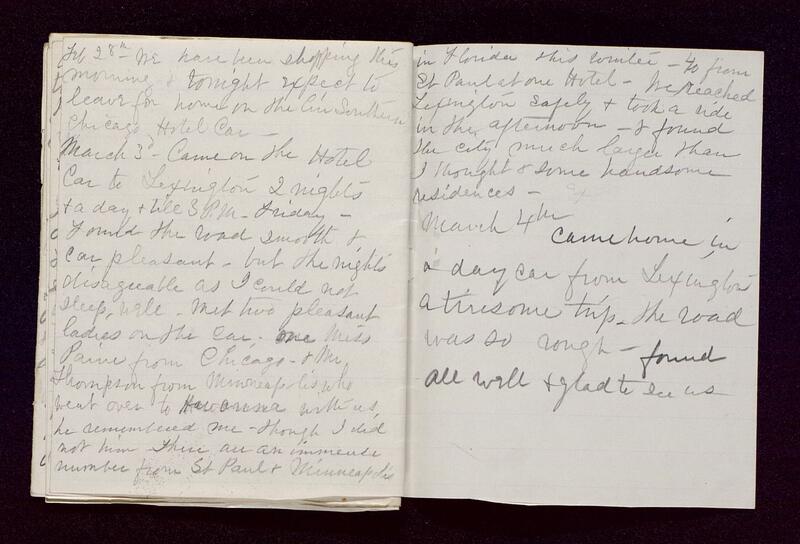 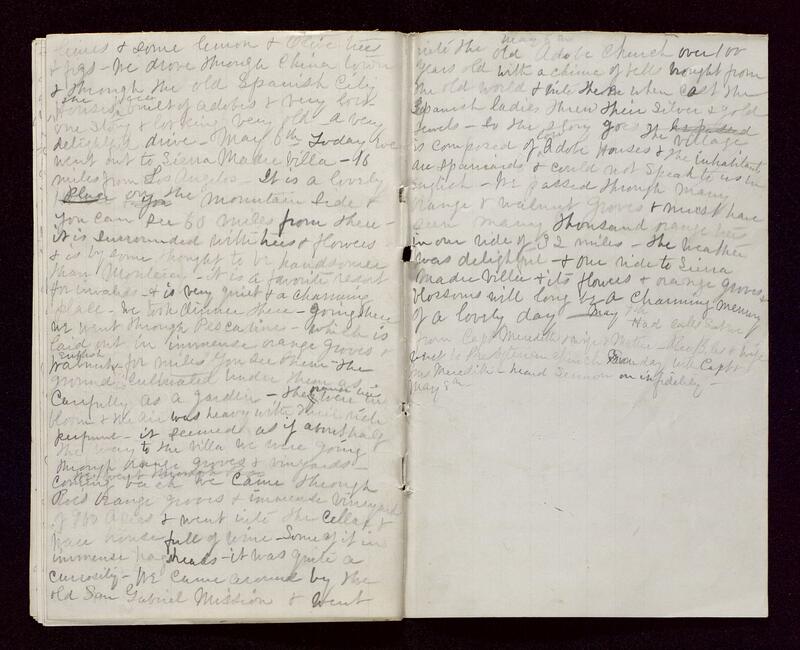 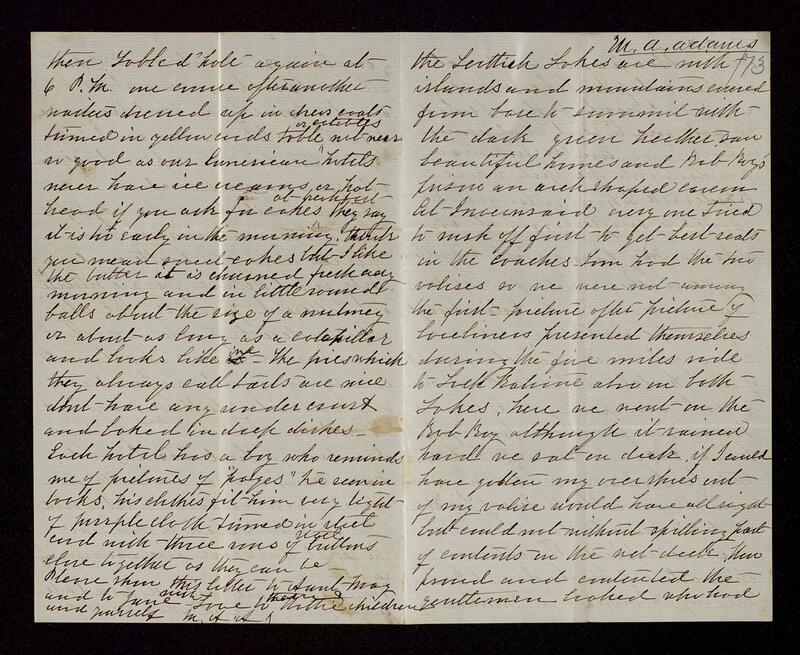 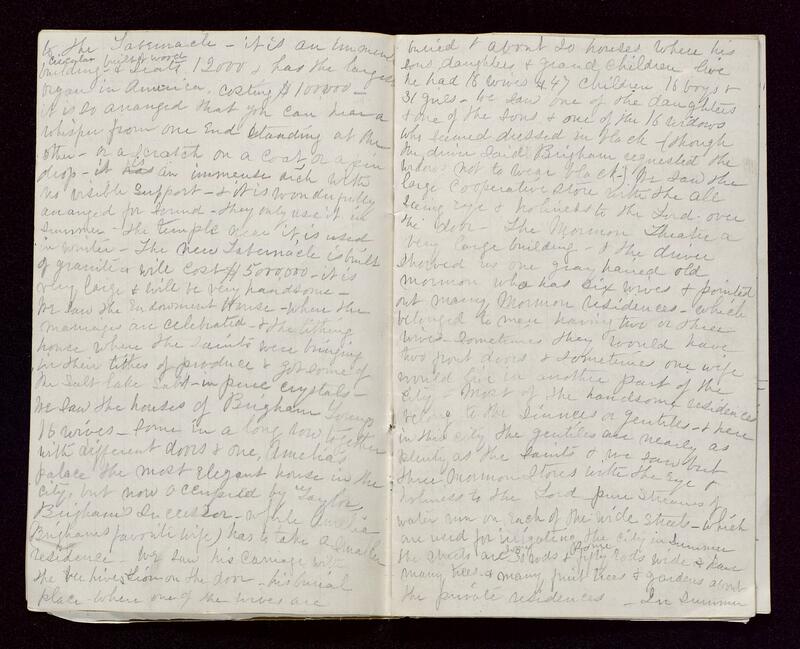 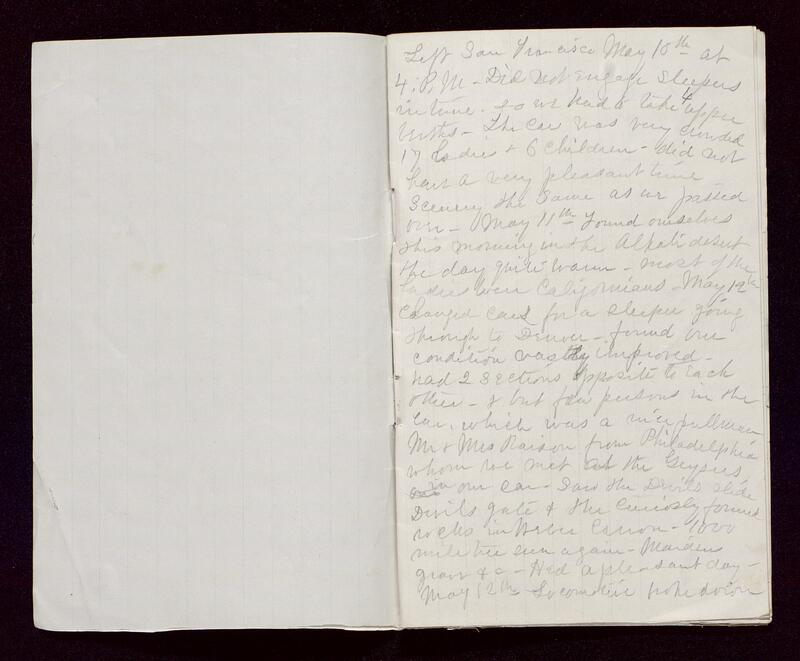 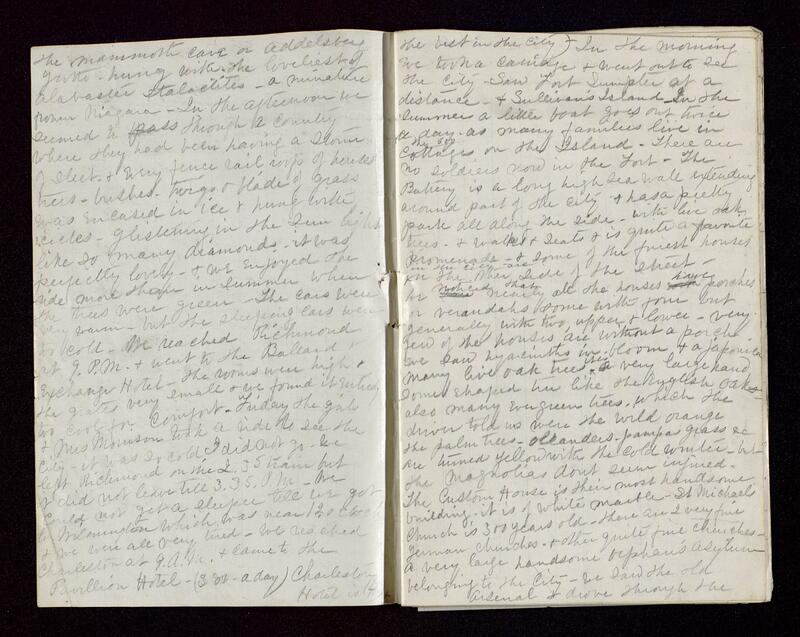 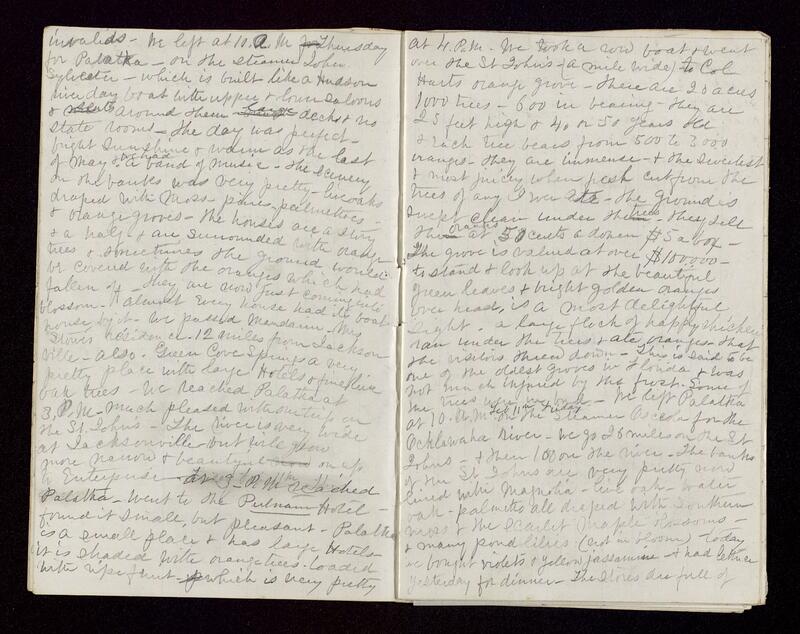 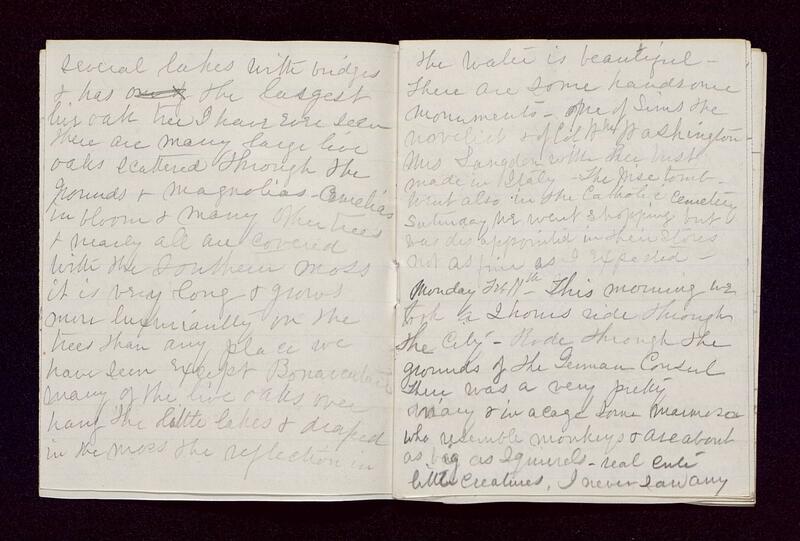 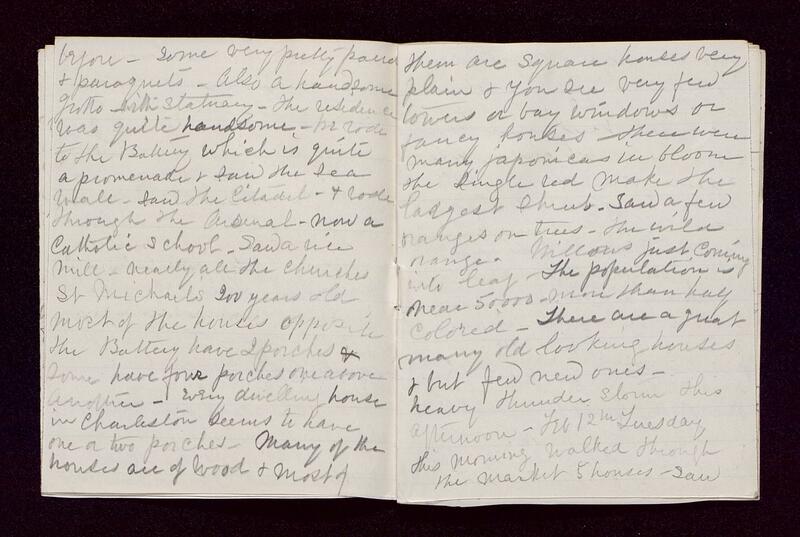 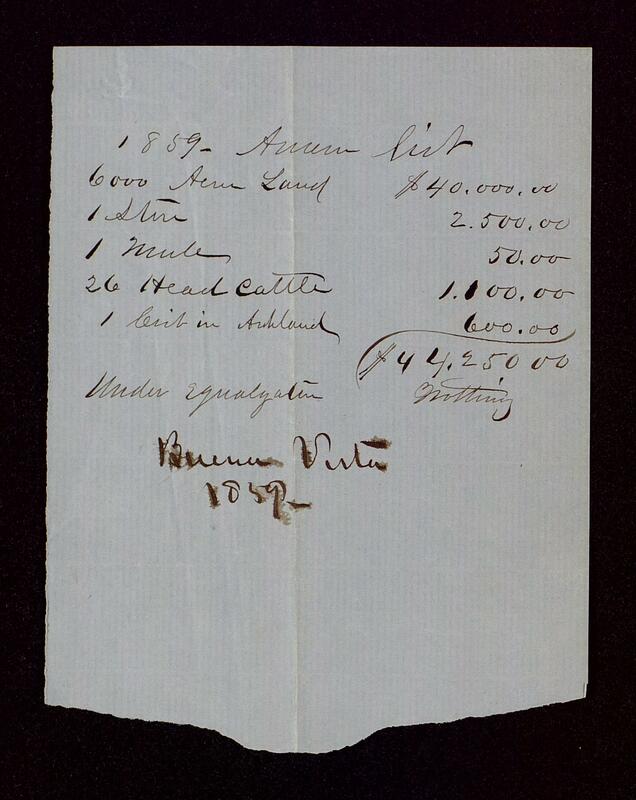 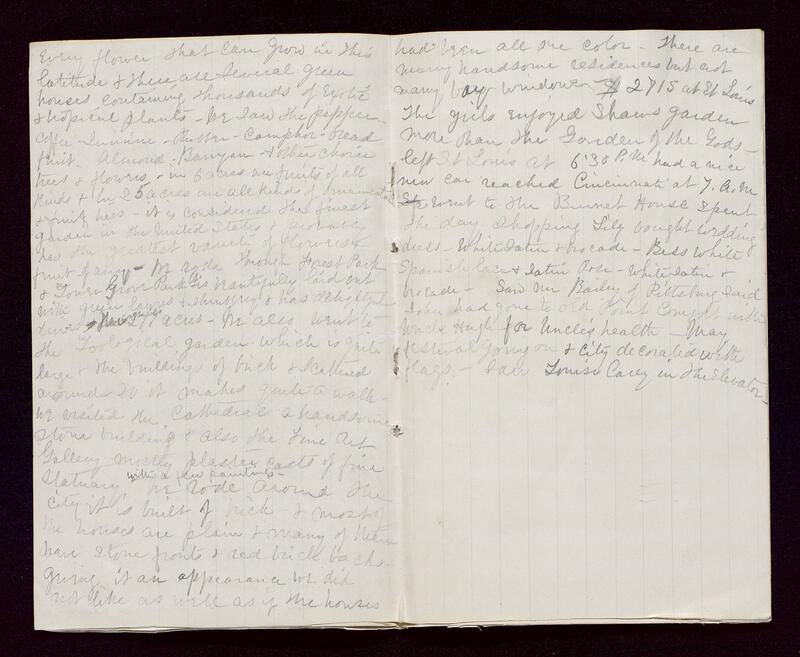 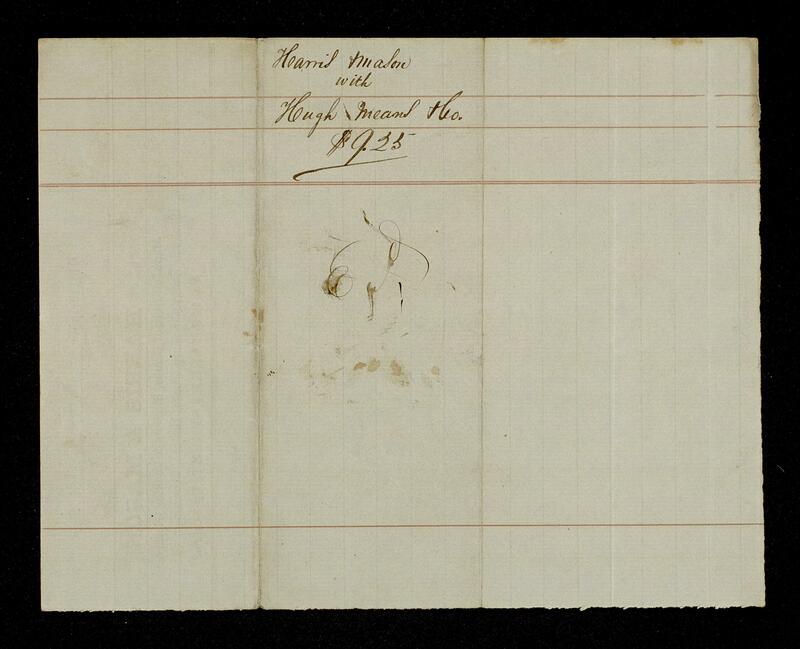 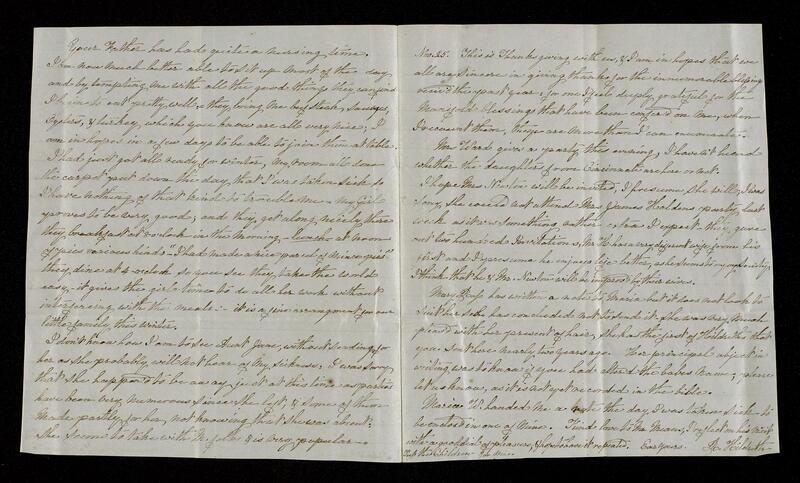 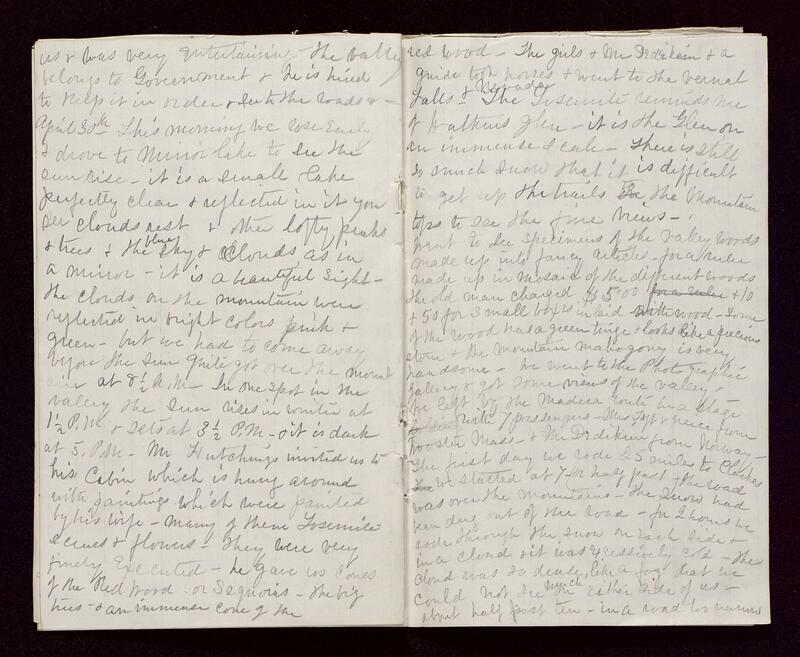 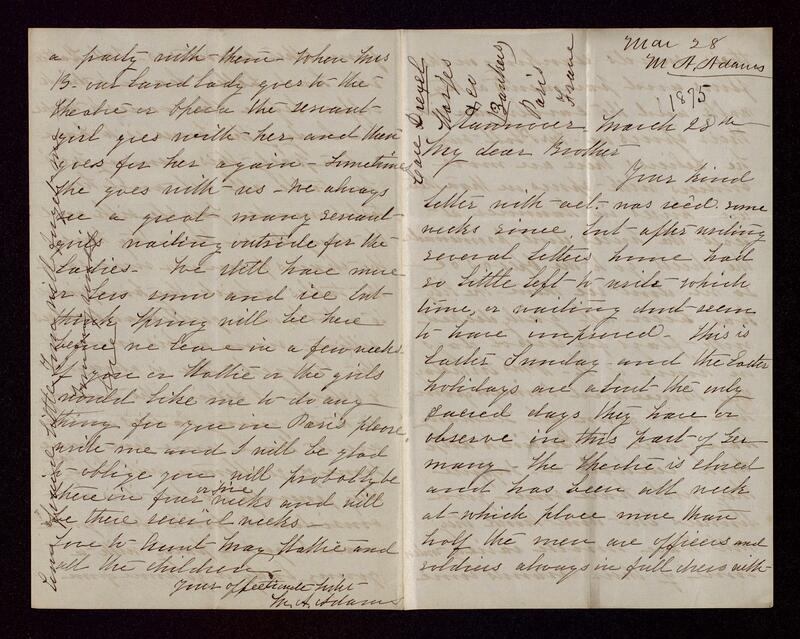 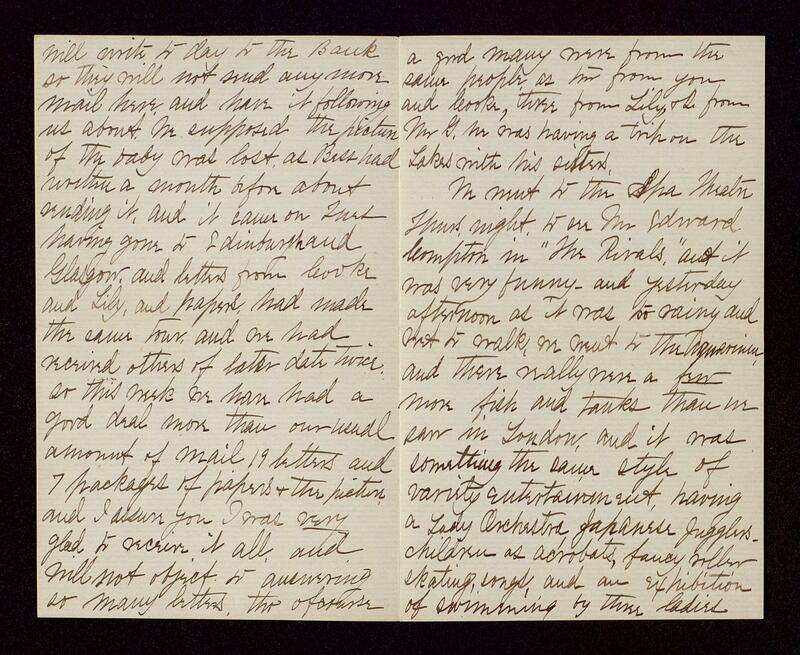 The personal papers of Harriet Means include accounts of a trip she took to Europe late in the decade. 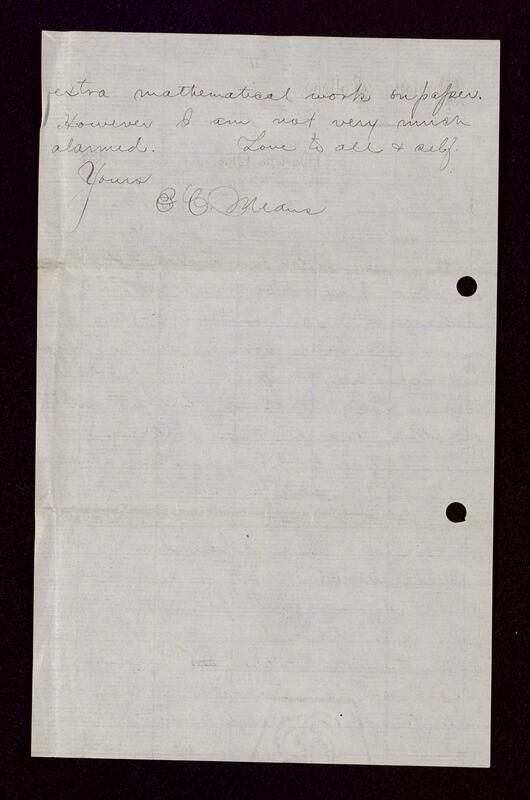 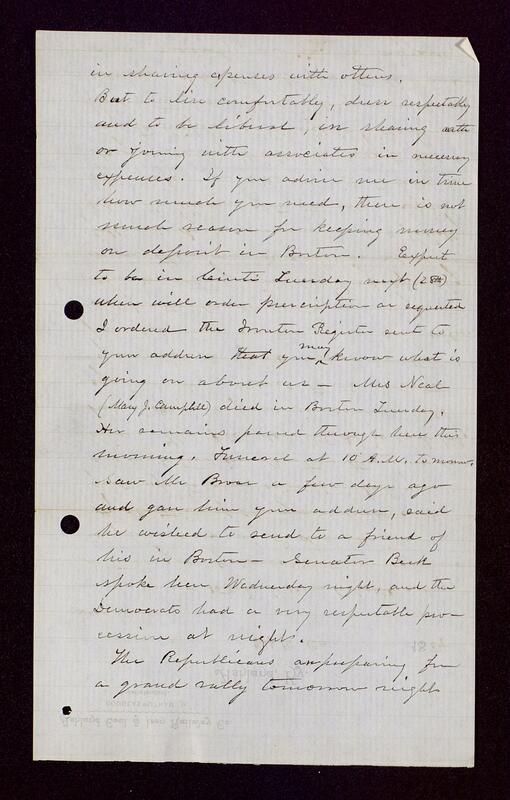 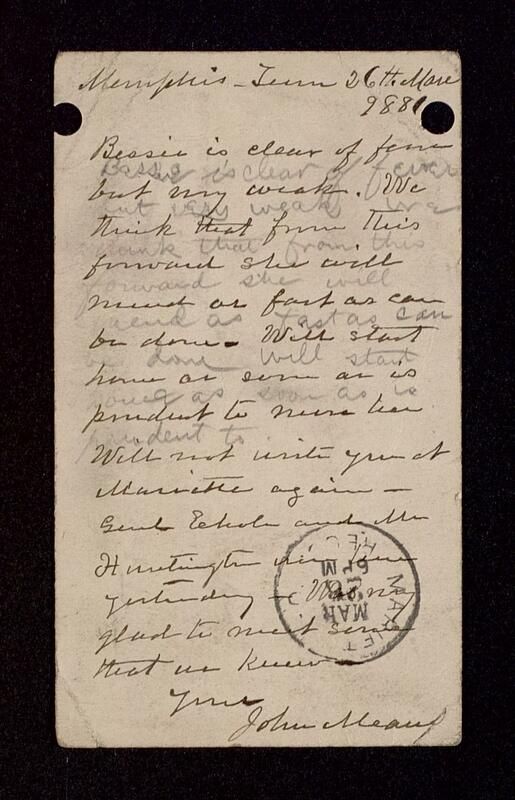 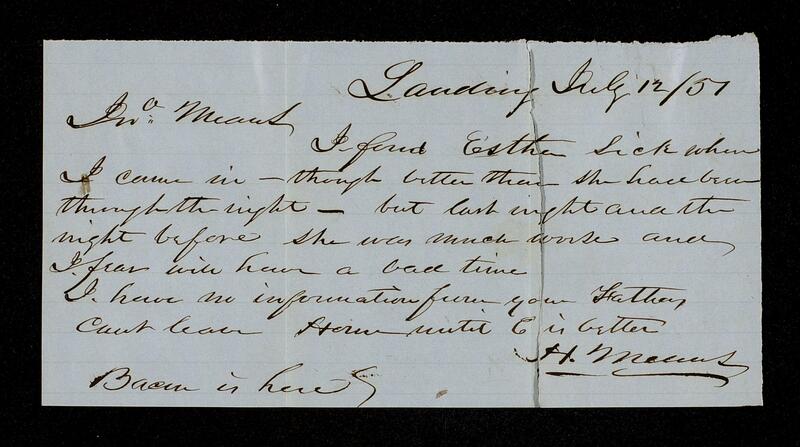 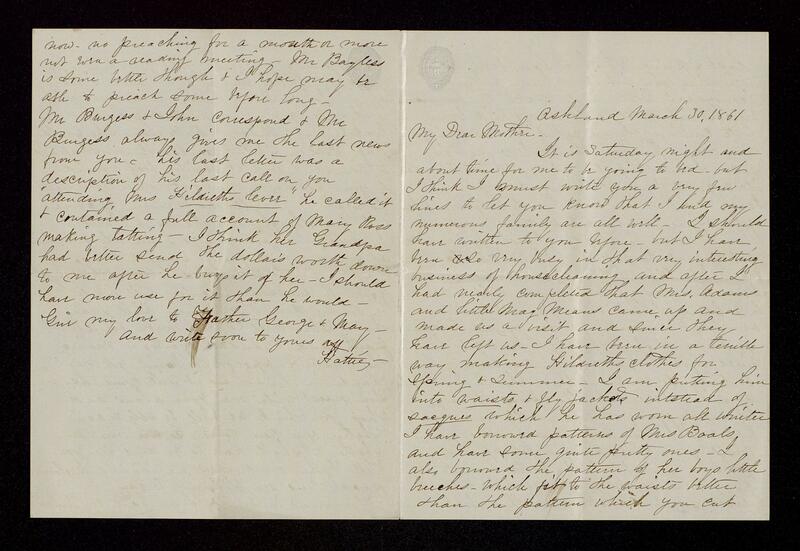 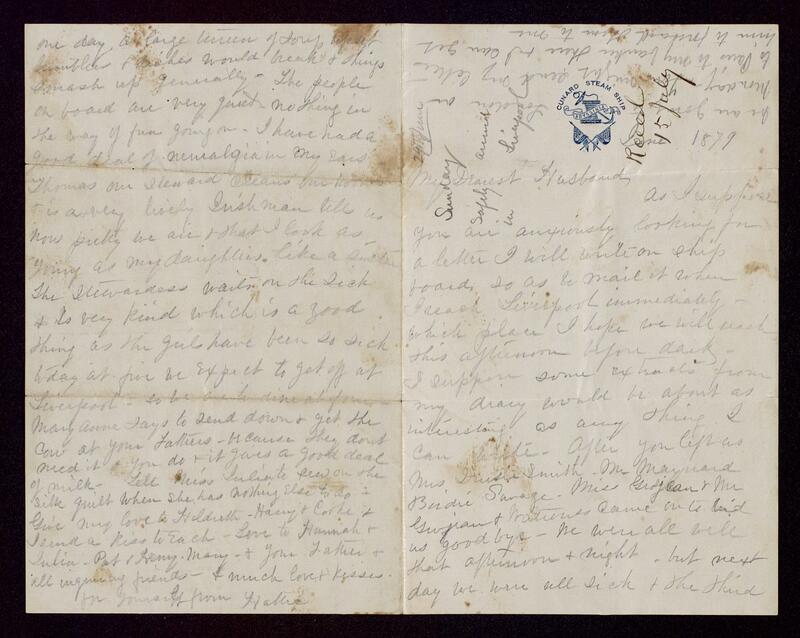 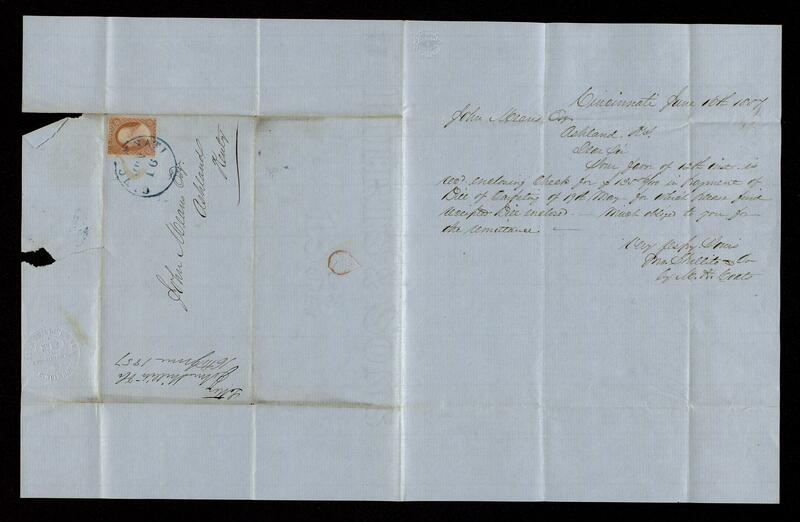 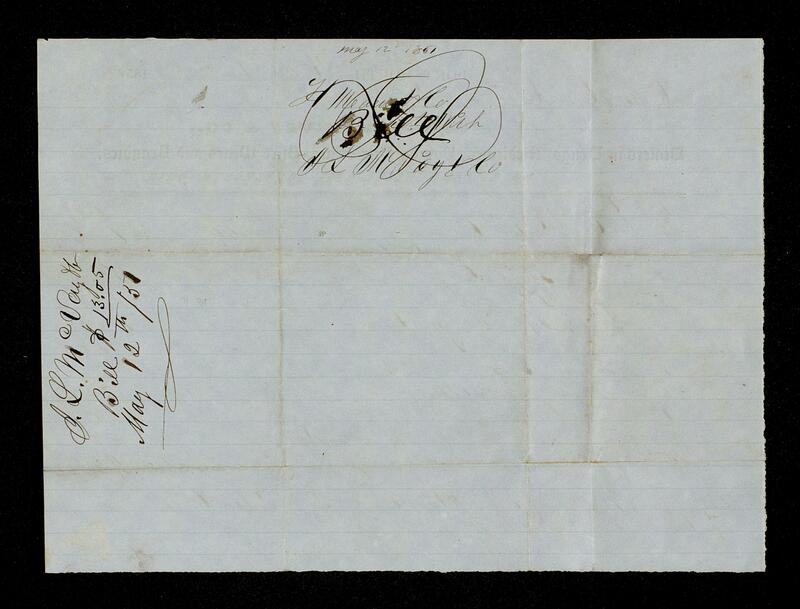 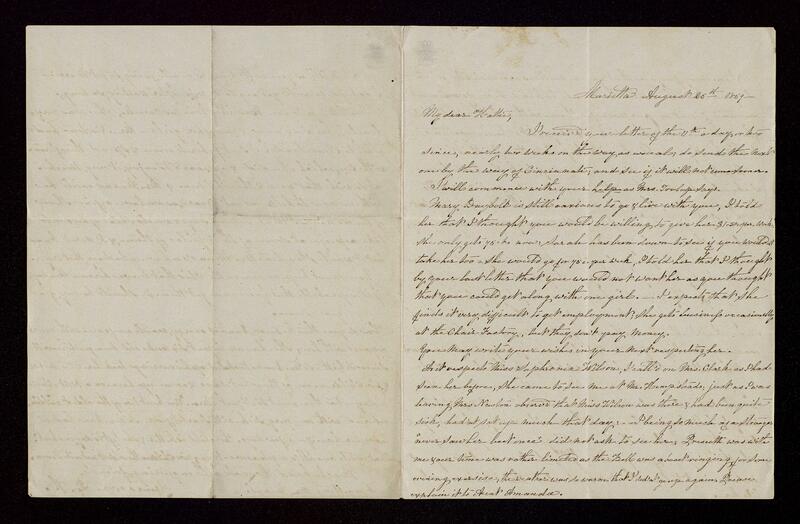 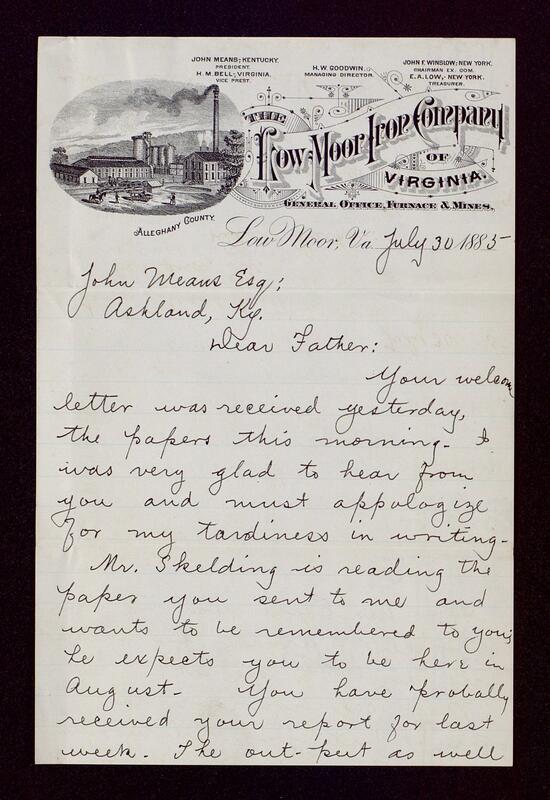 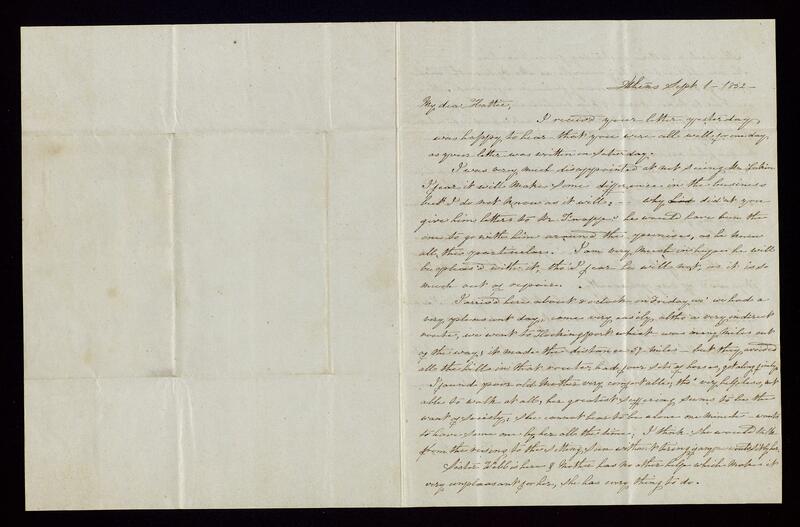 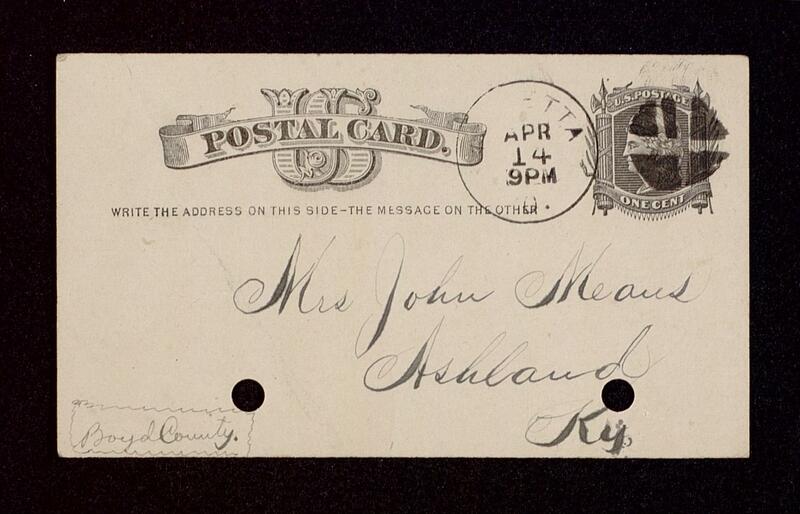 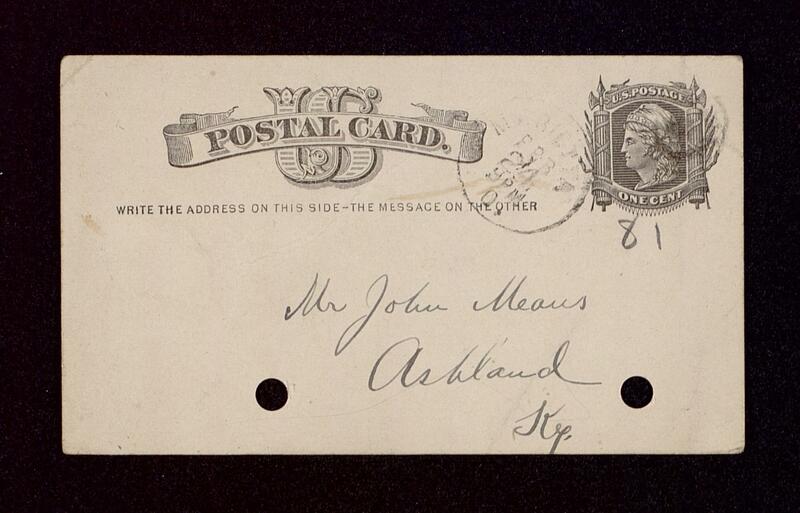 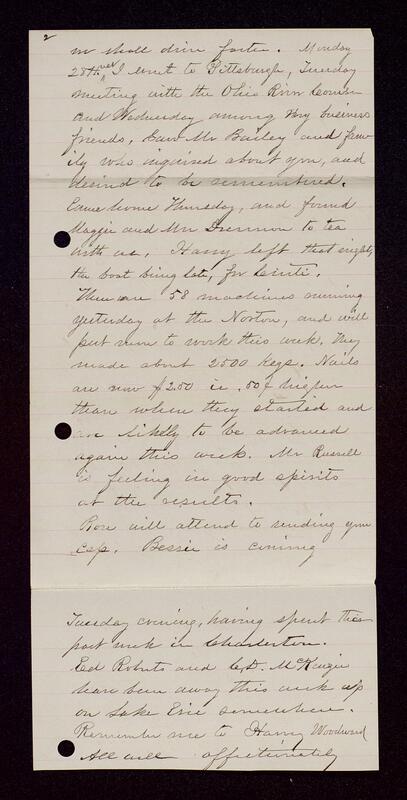 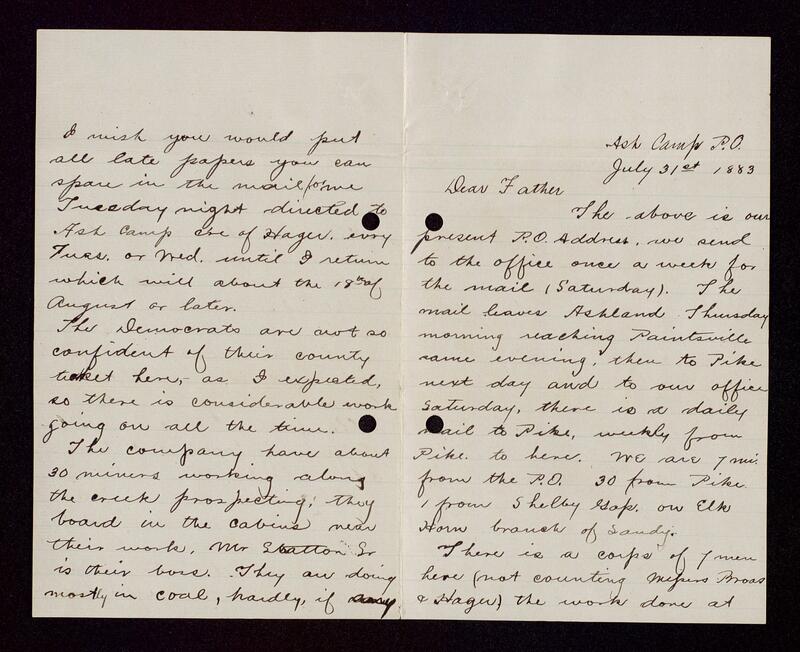 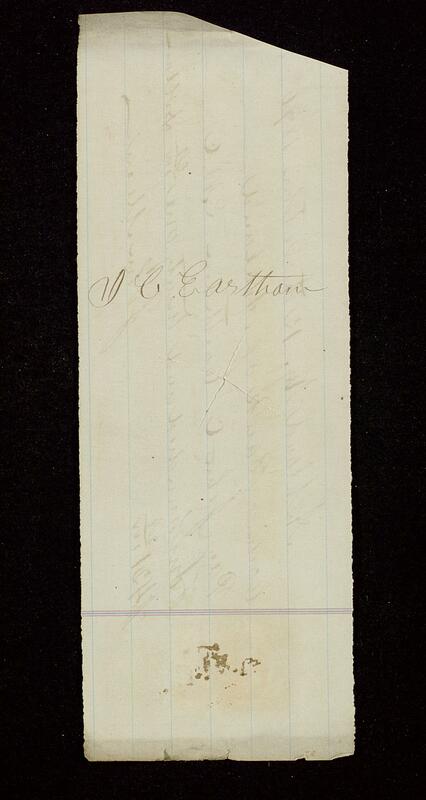 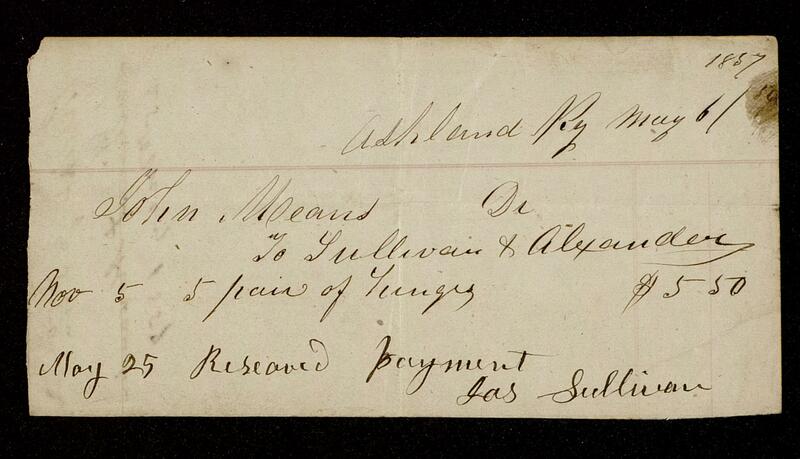 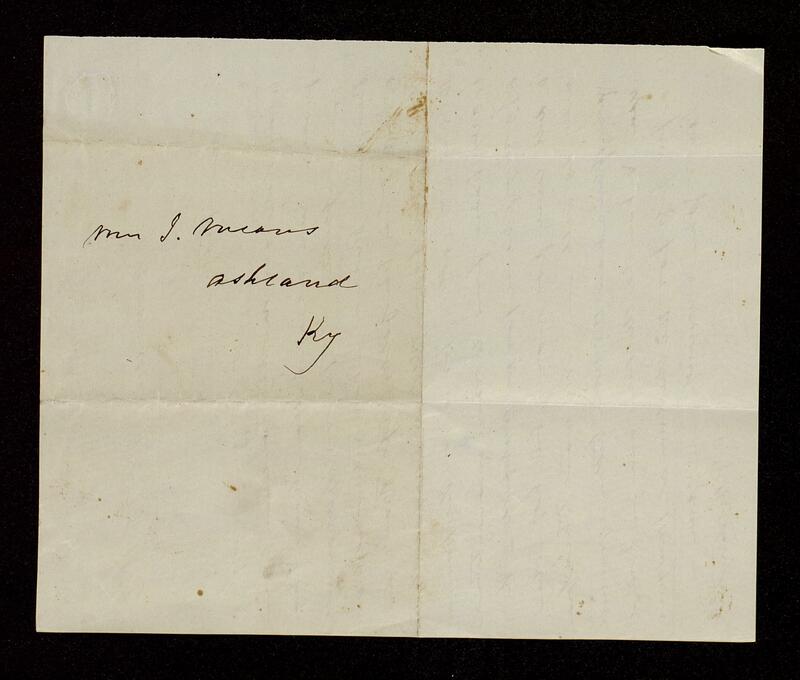 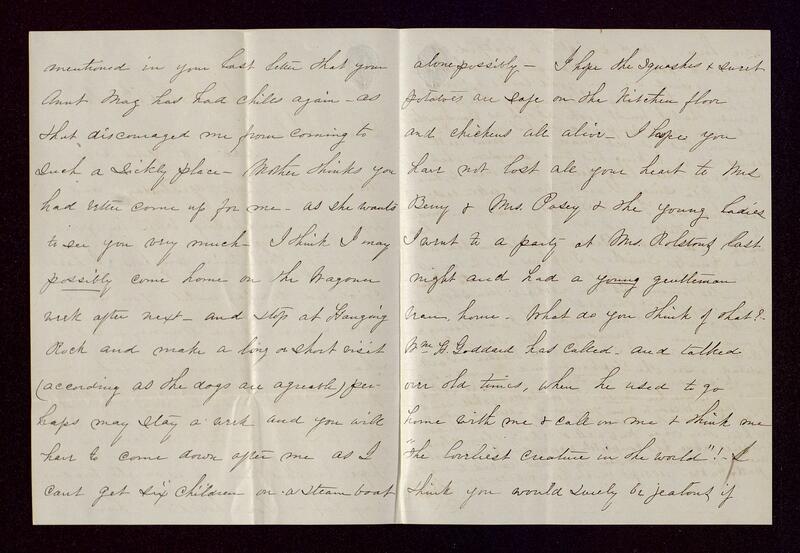 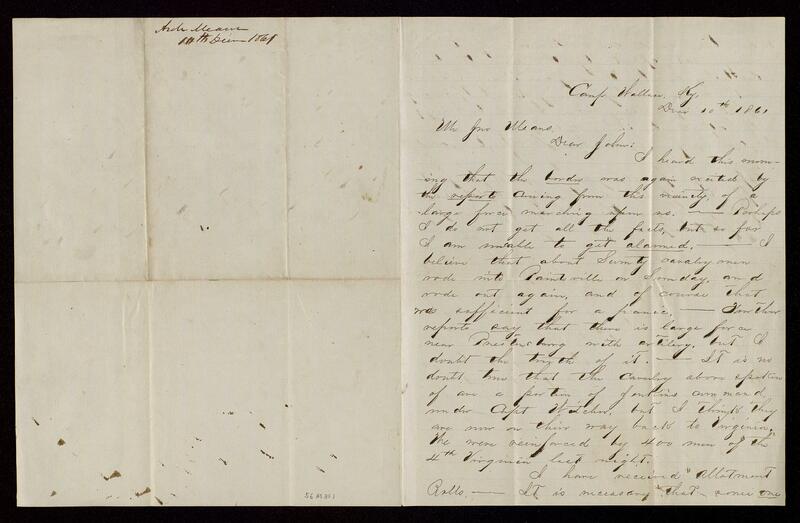 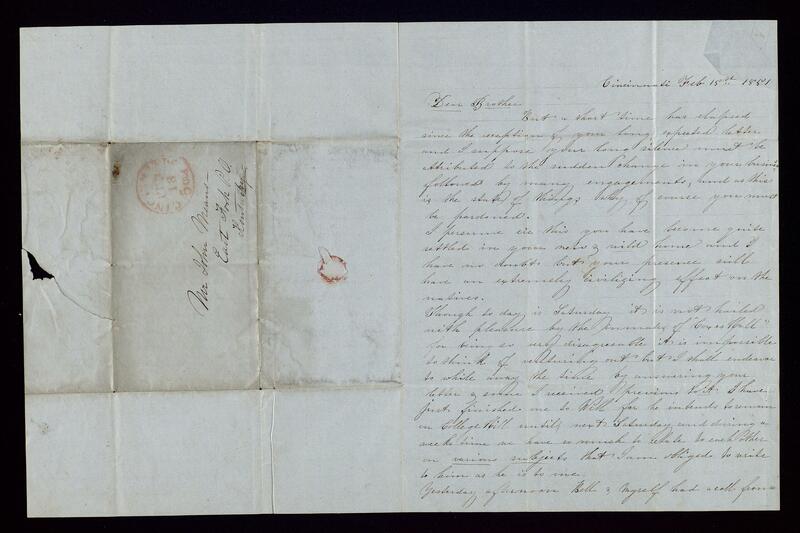 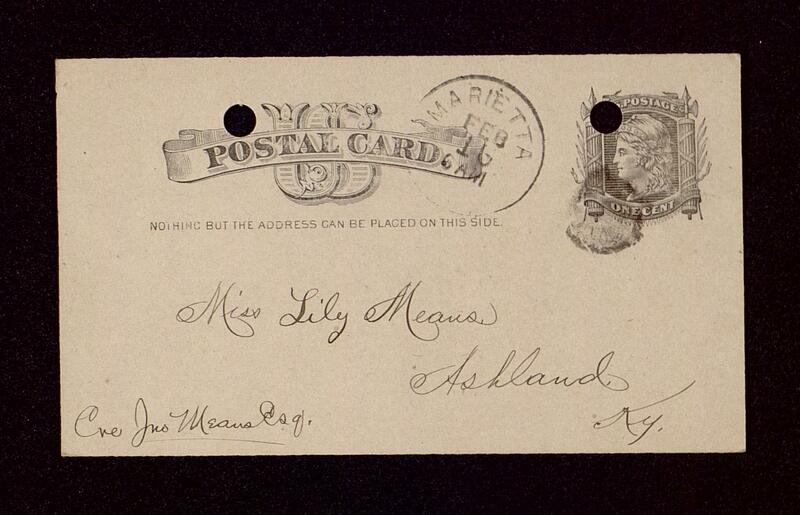 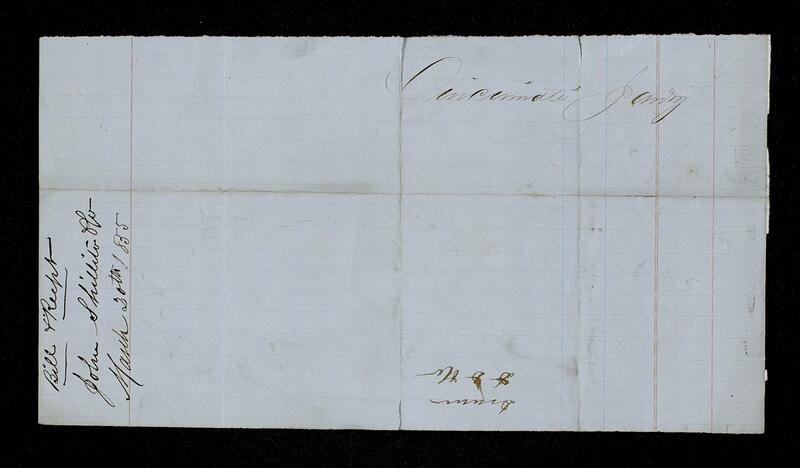 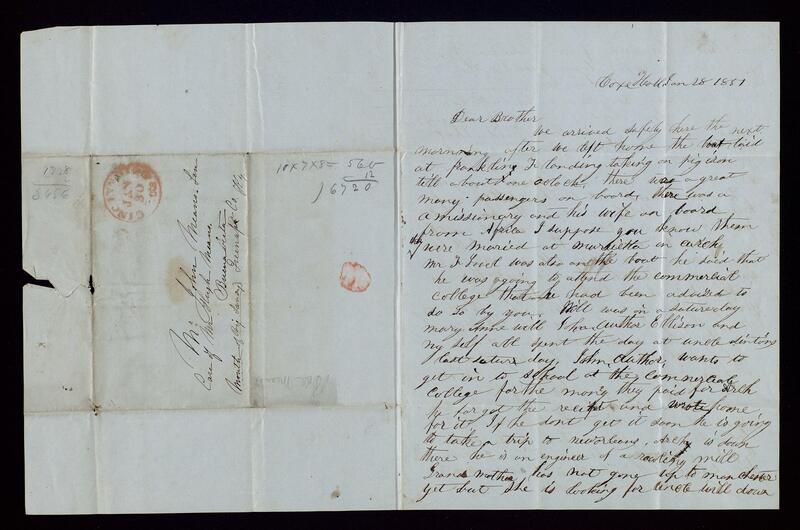 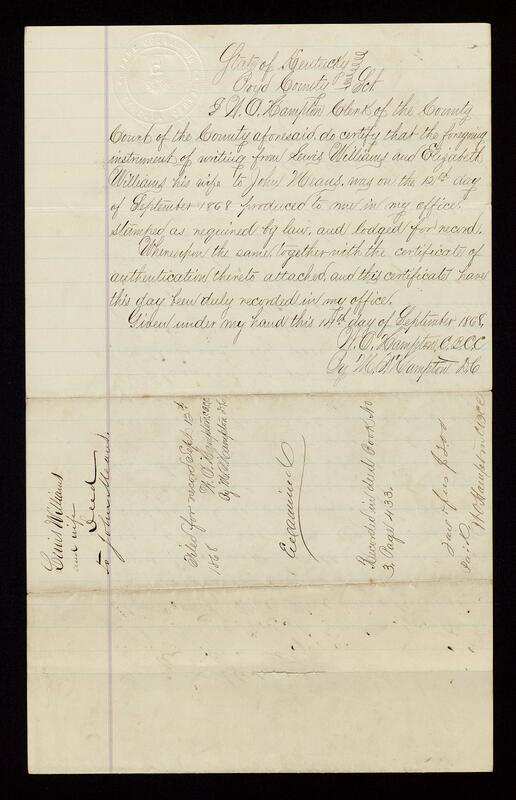 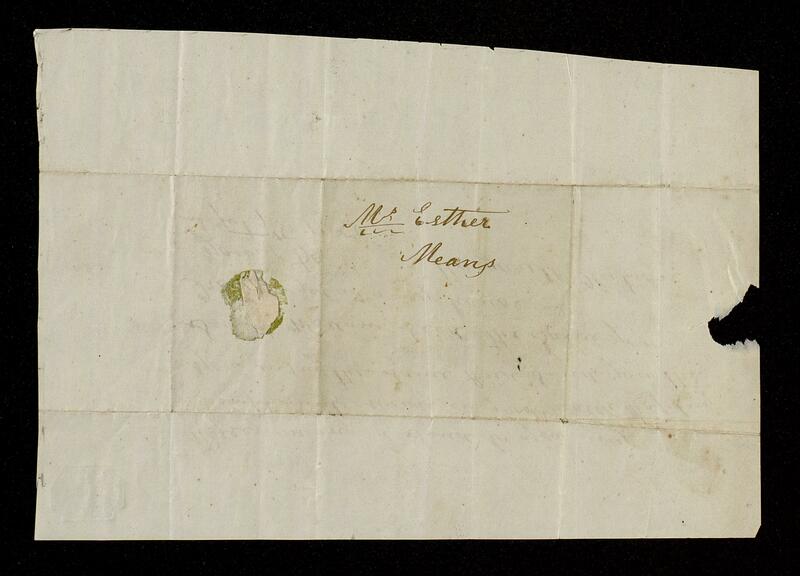 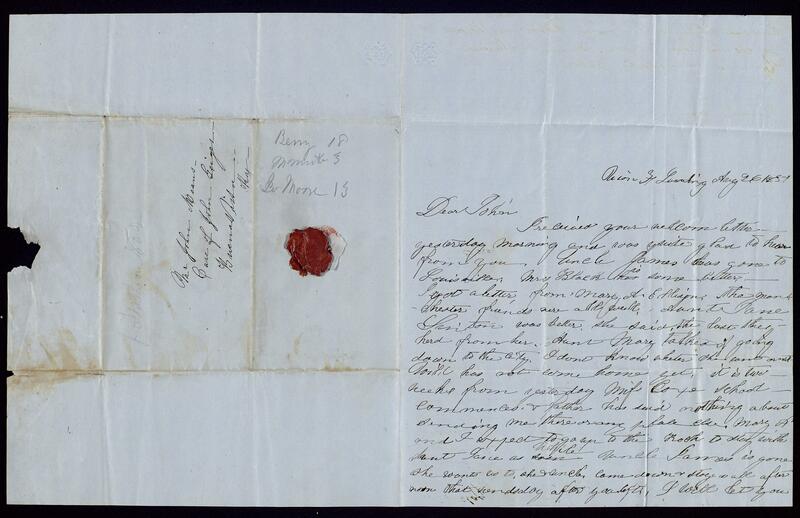 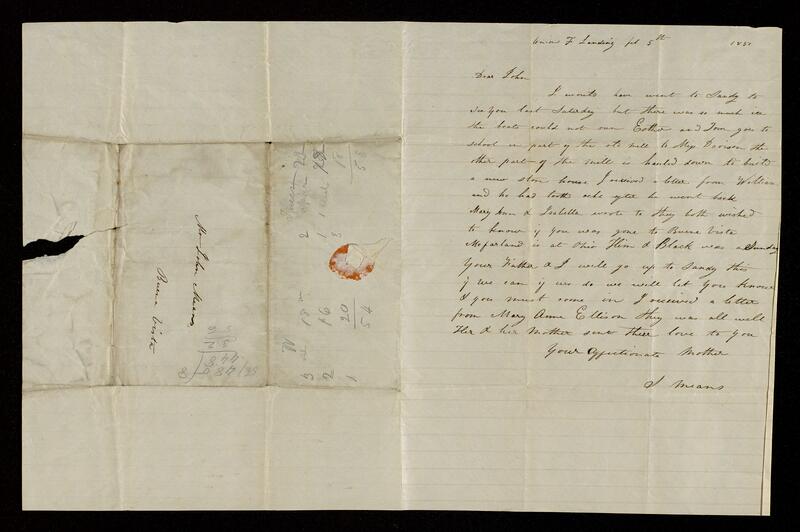 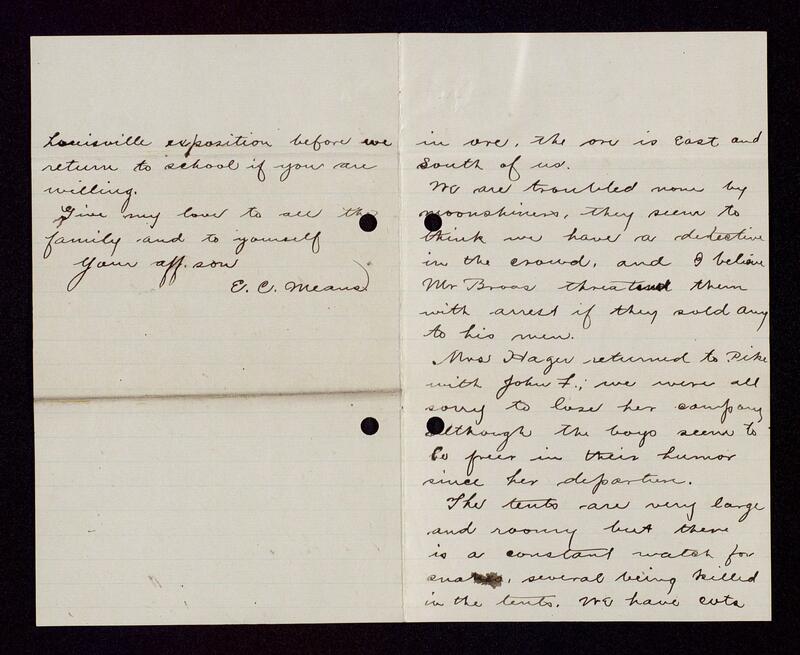 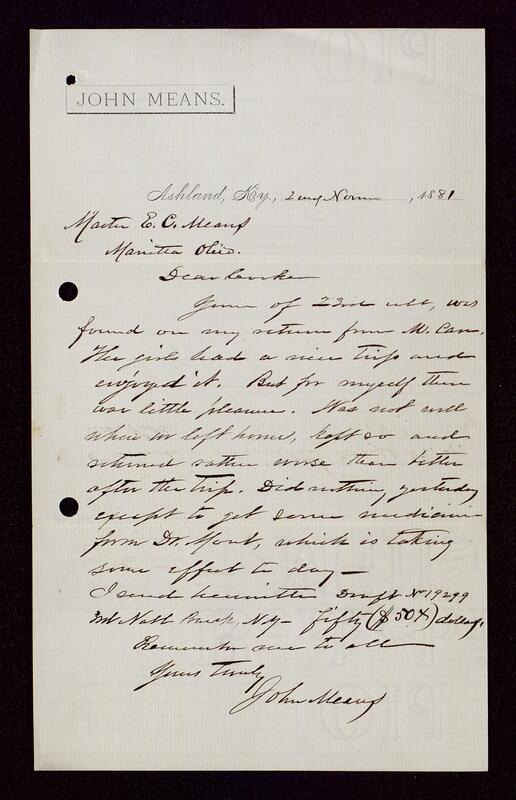 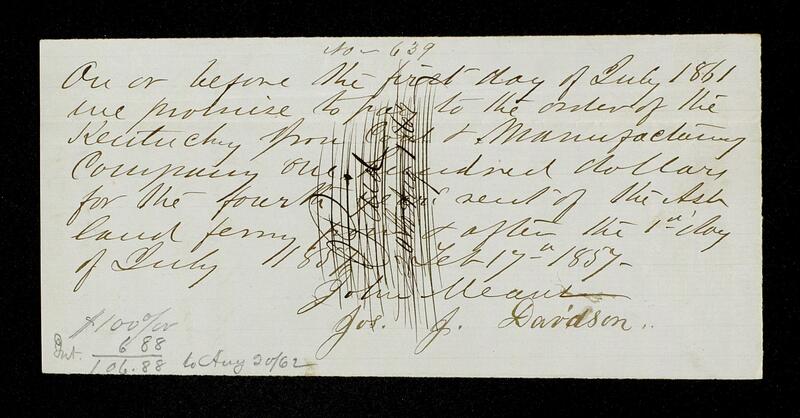 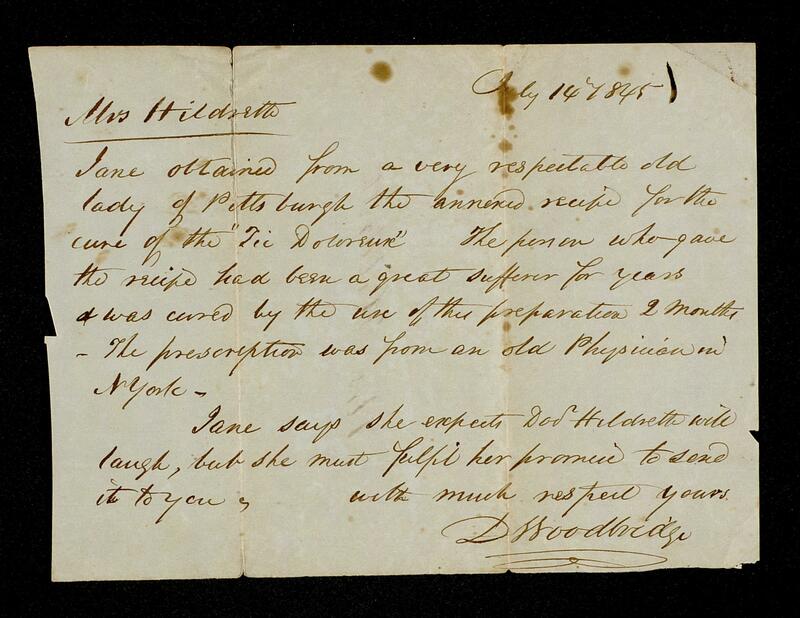 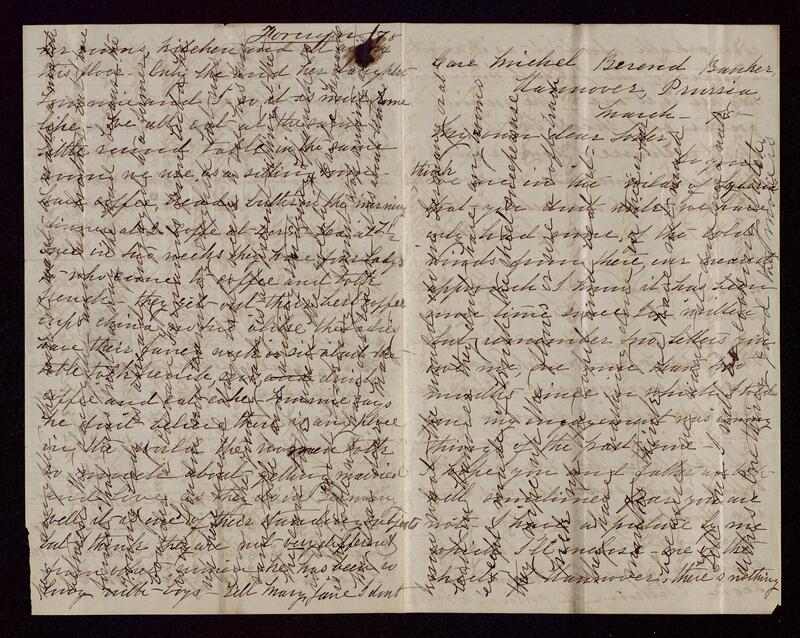 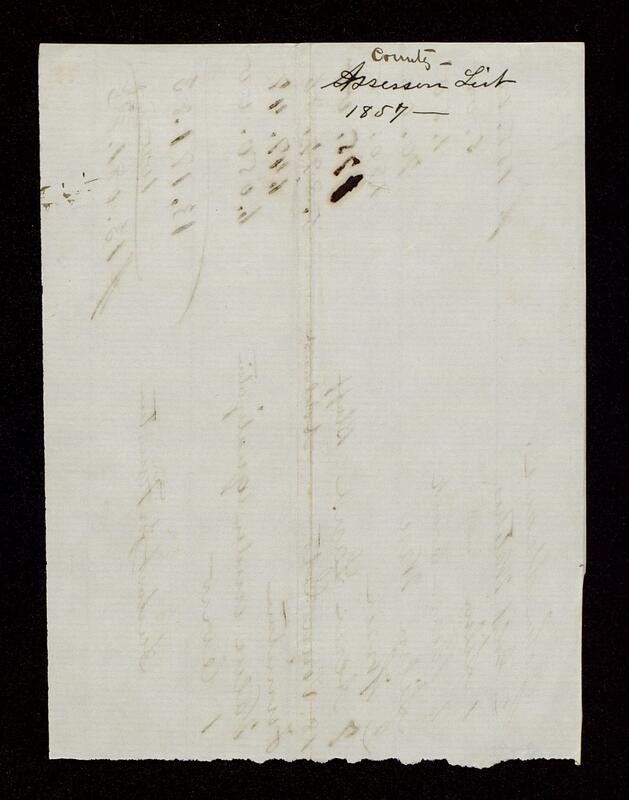 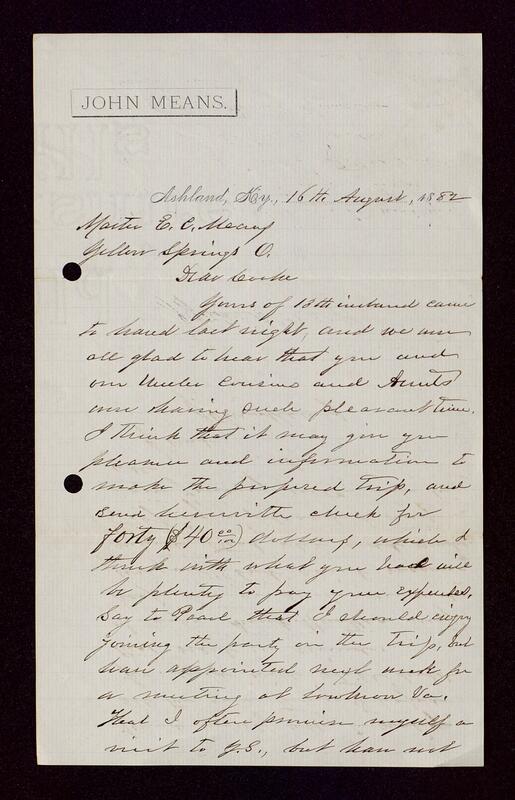 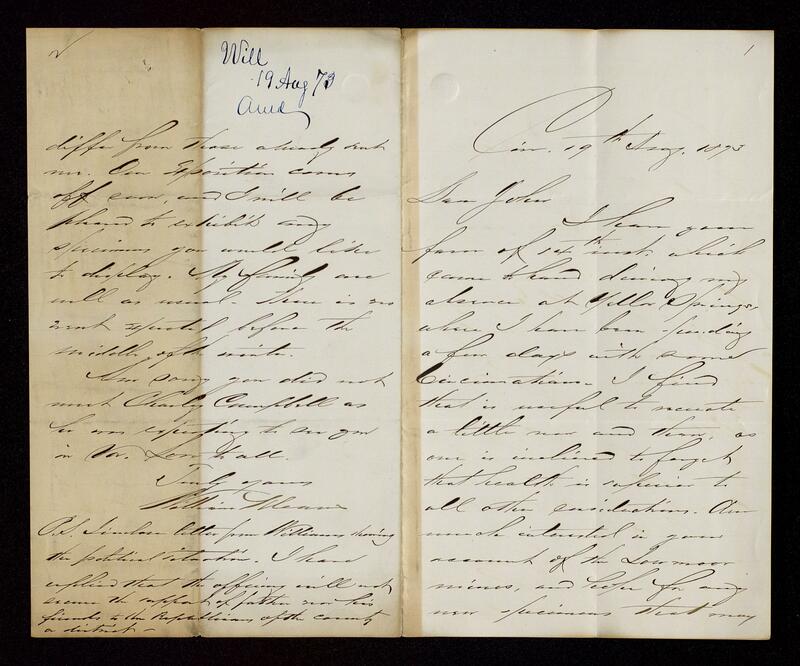 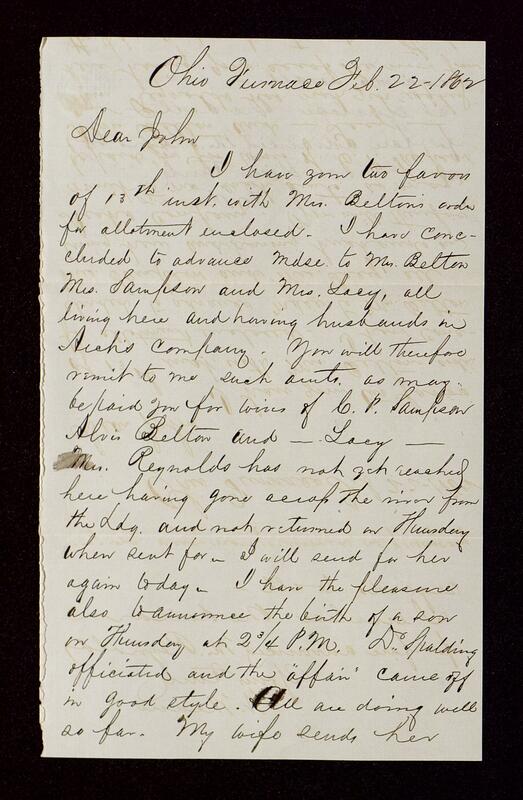 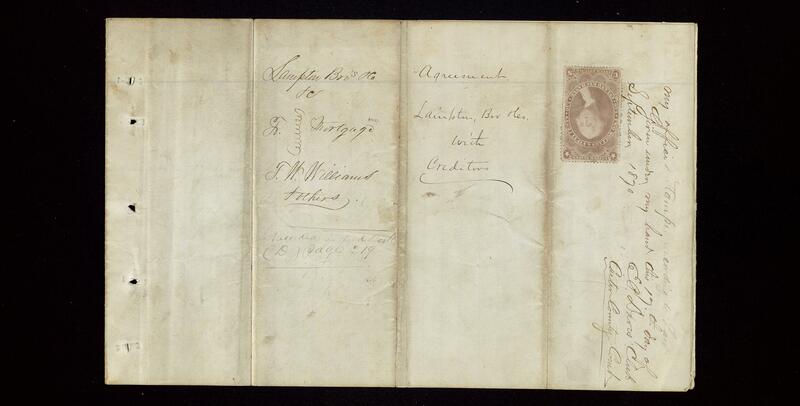 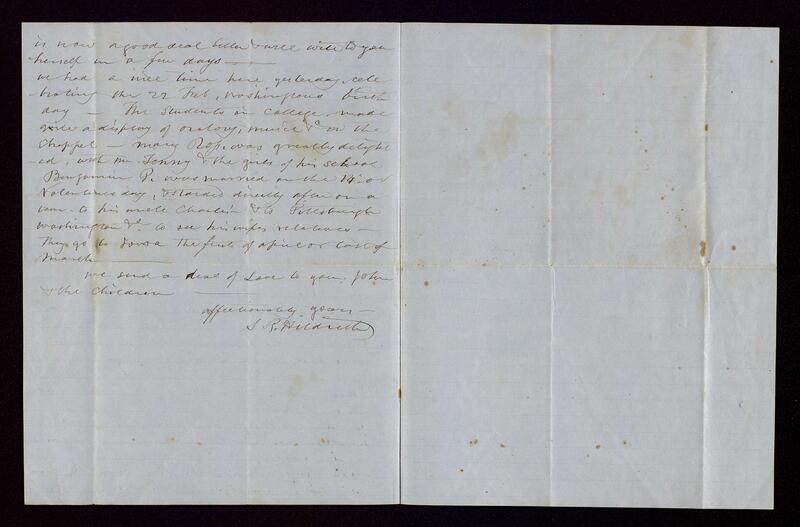 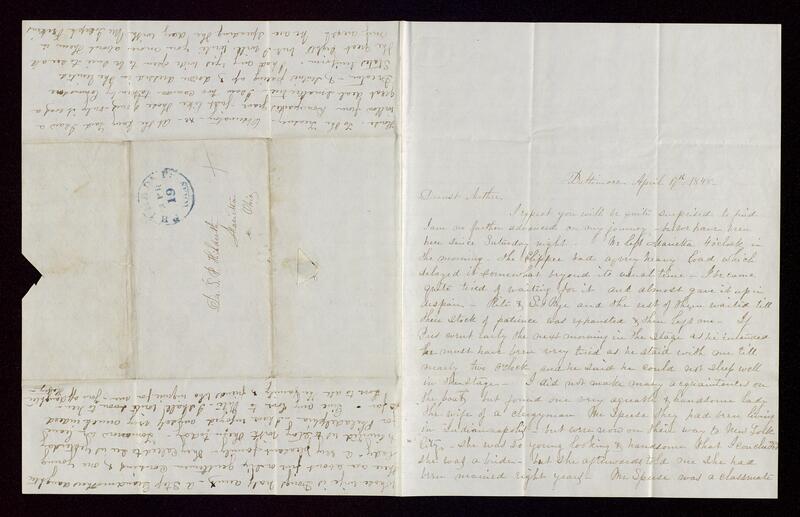 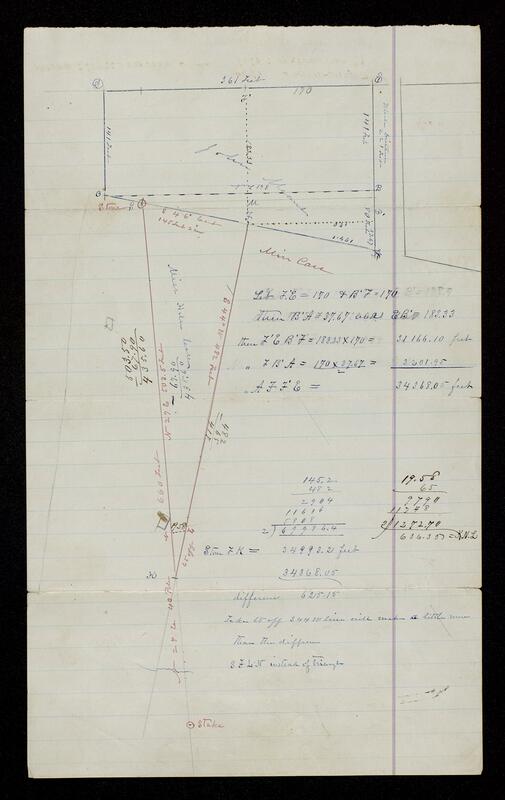 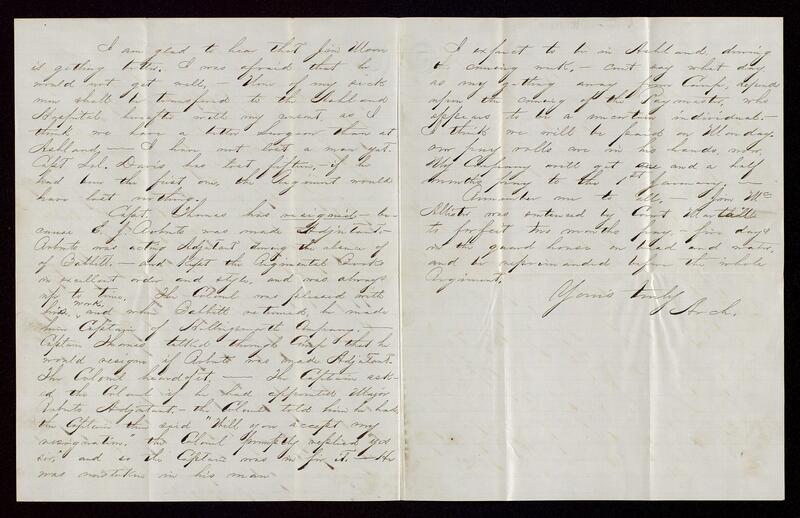 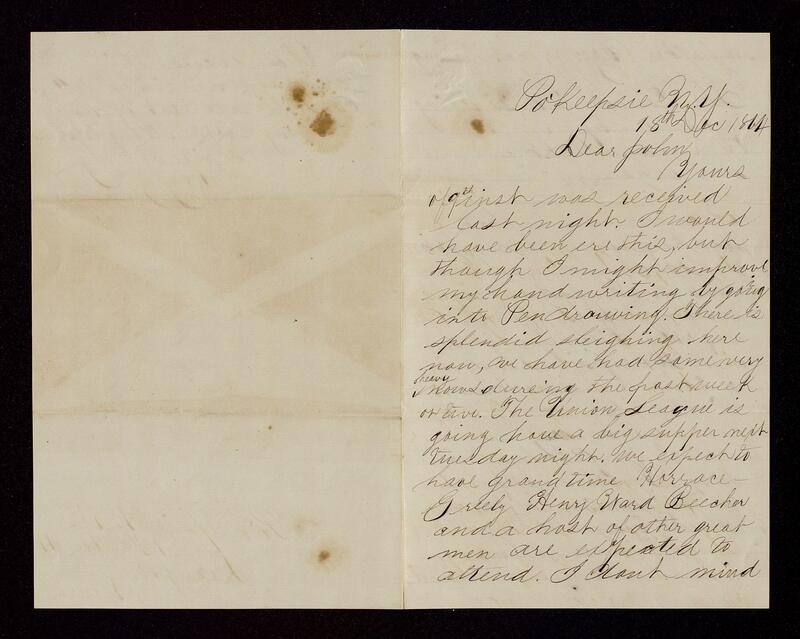 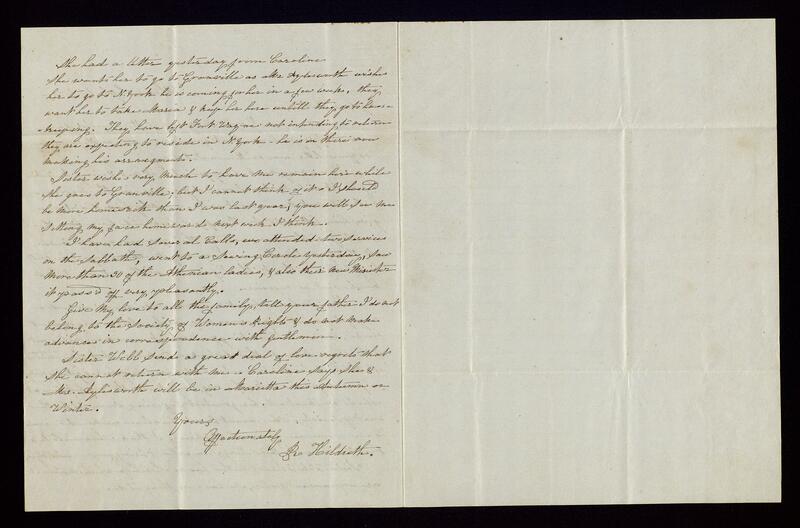 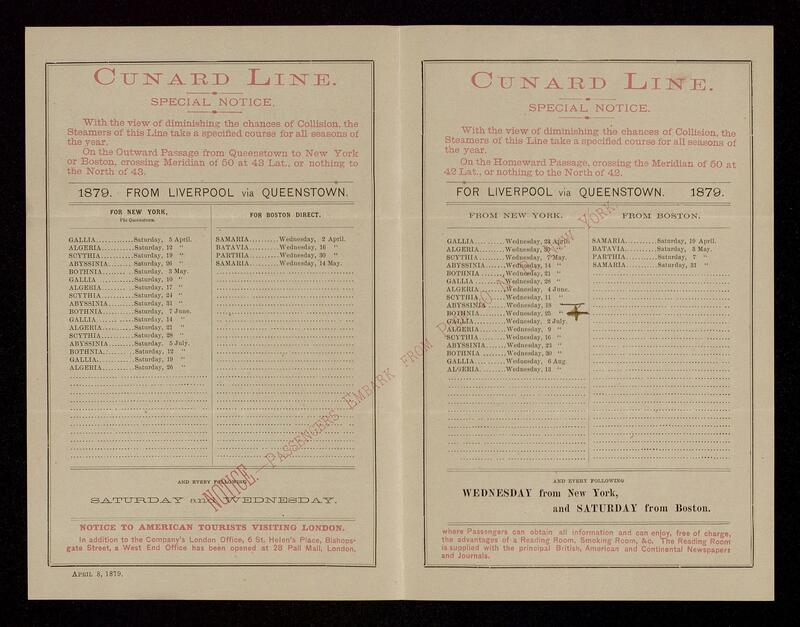 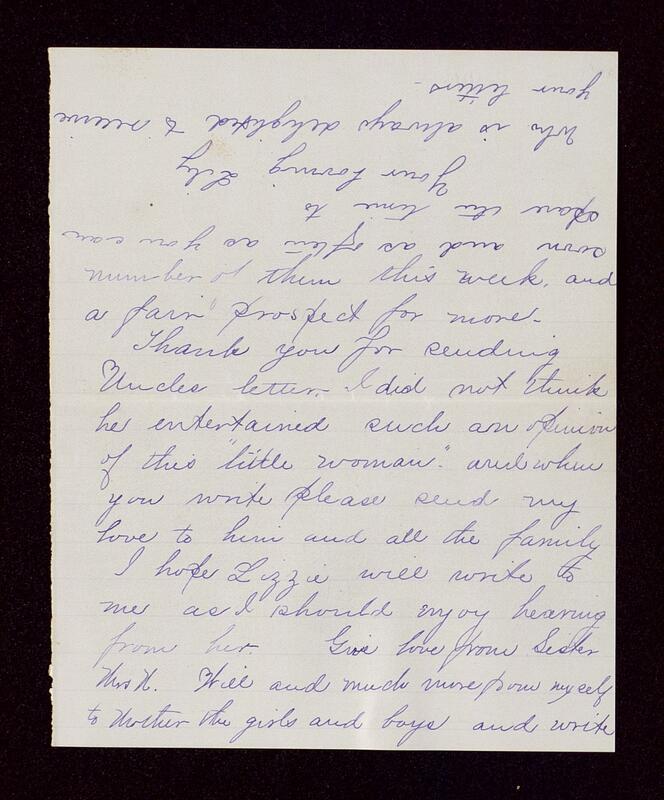 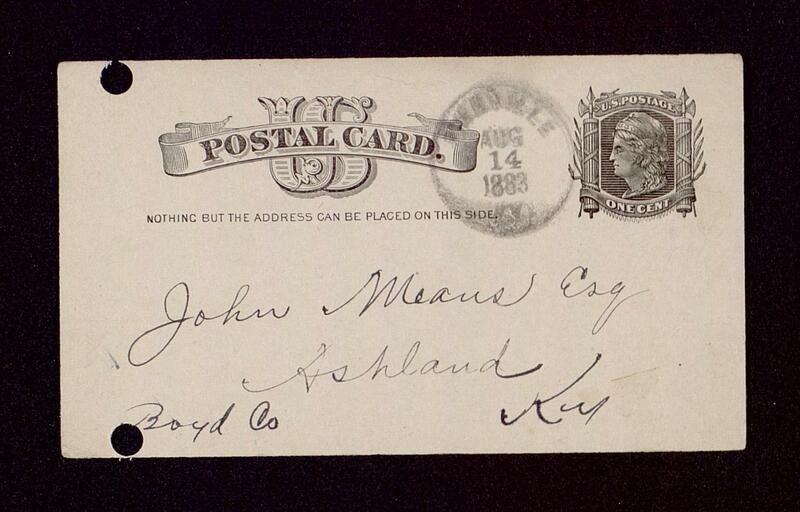 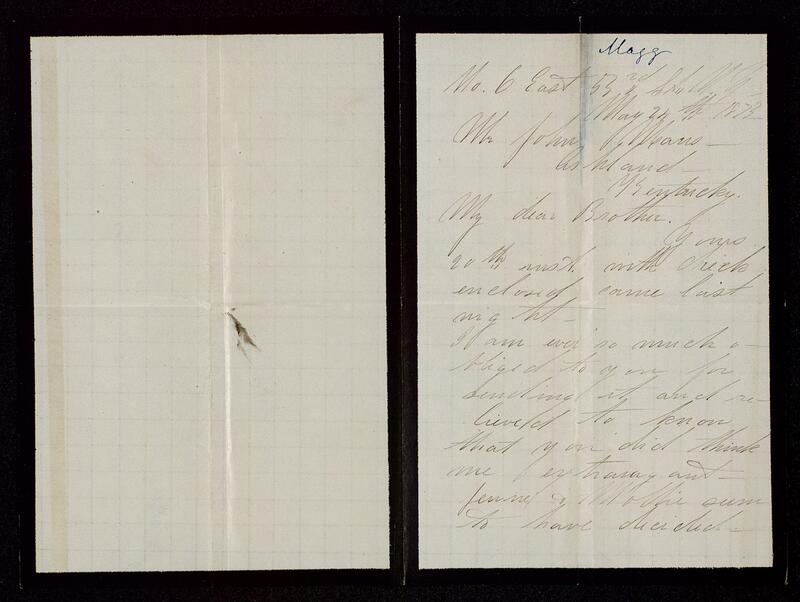 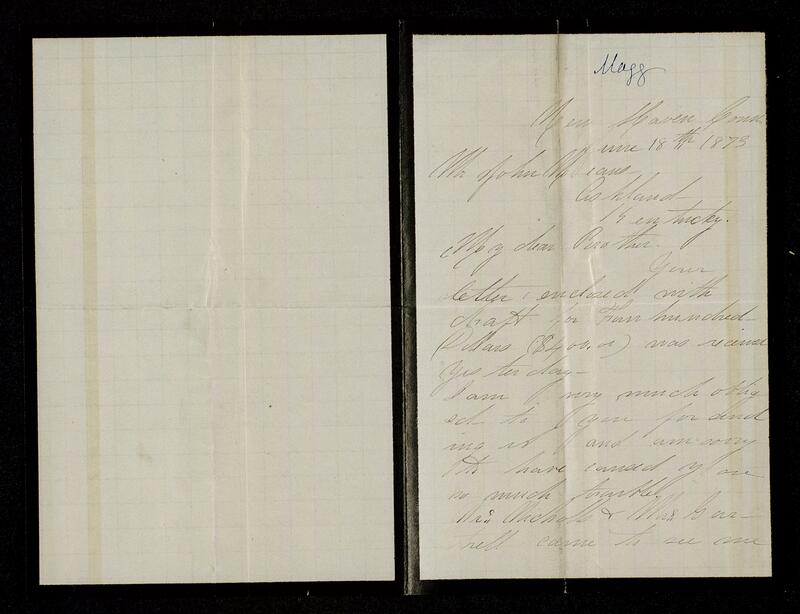 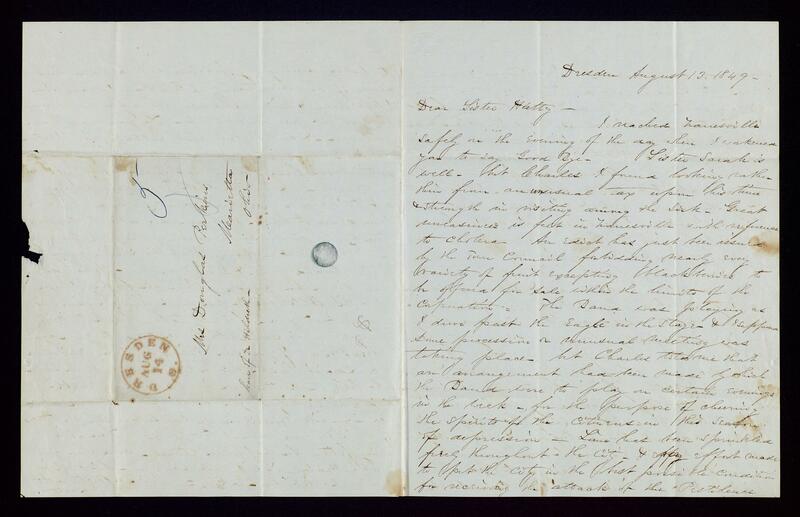 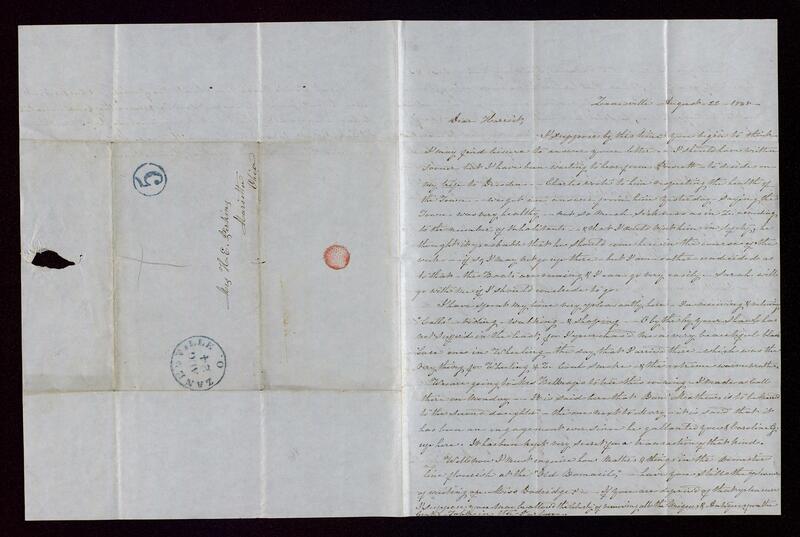 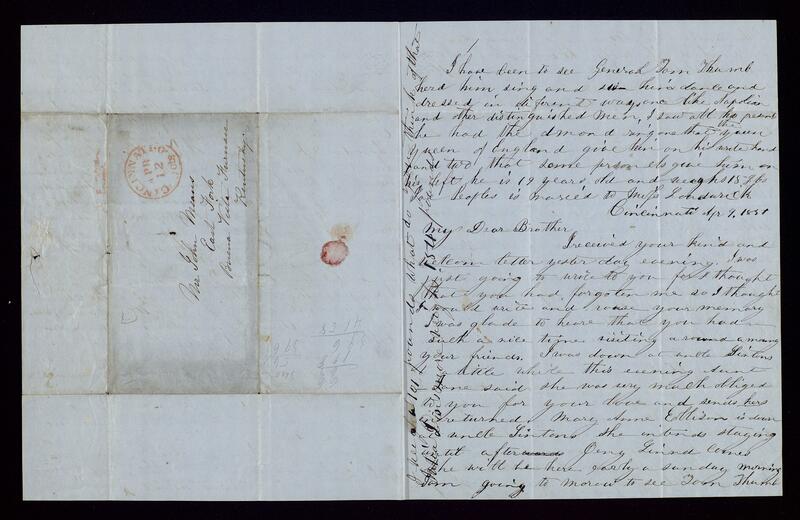 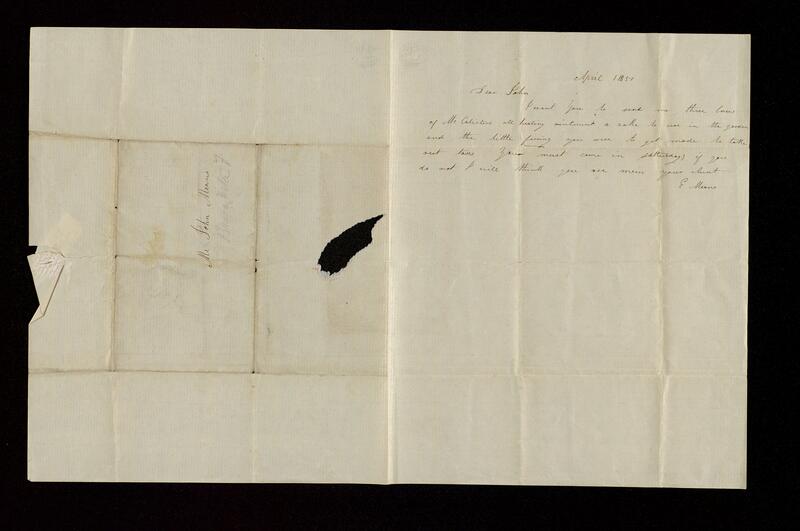 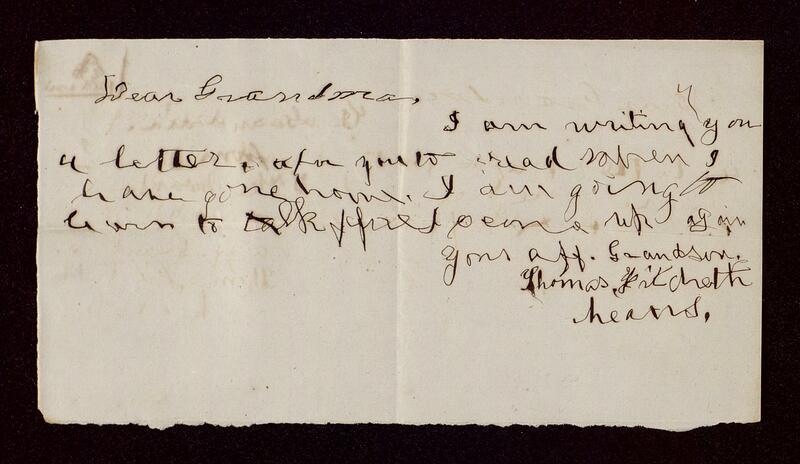 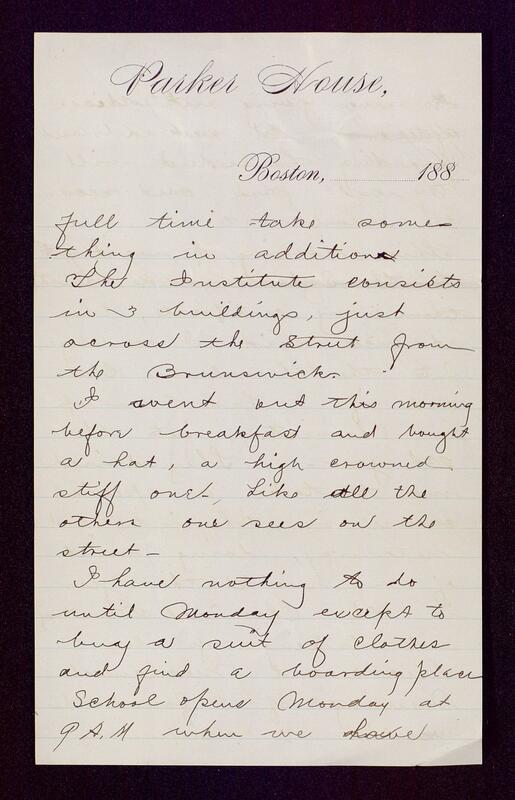 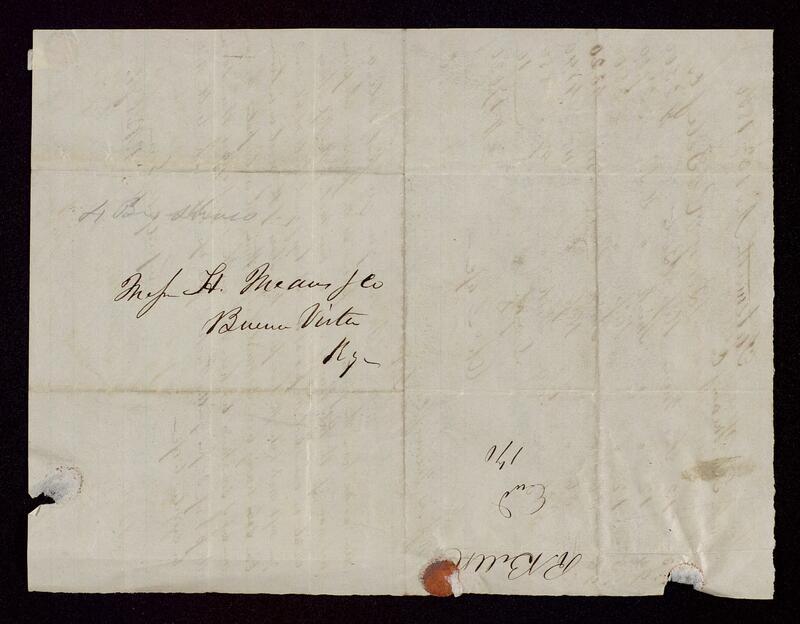 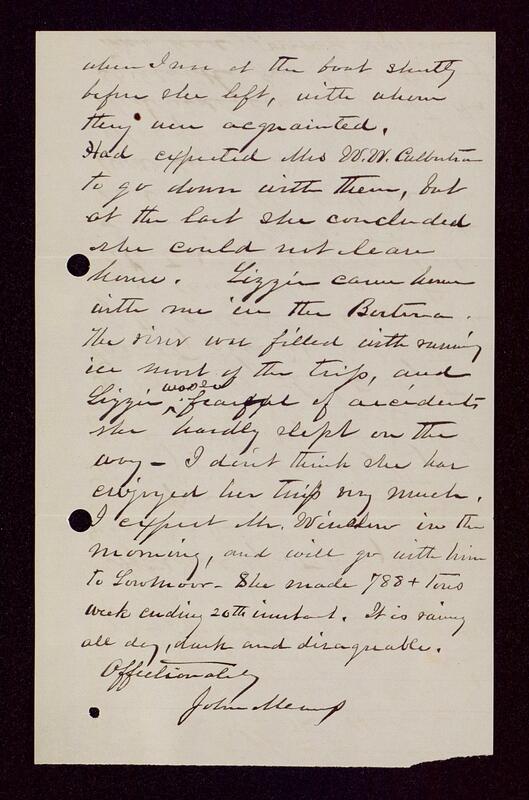 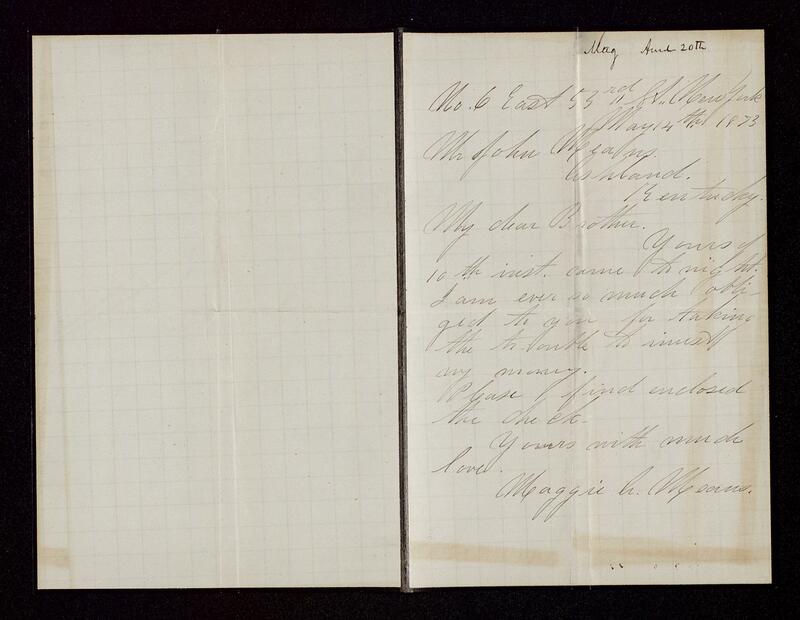 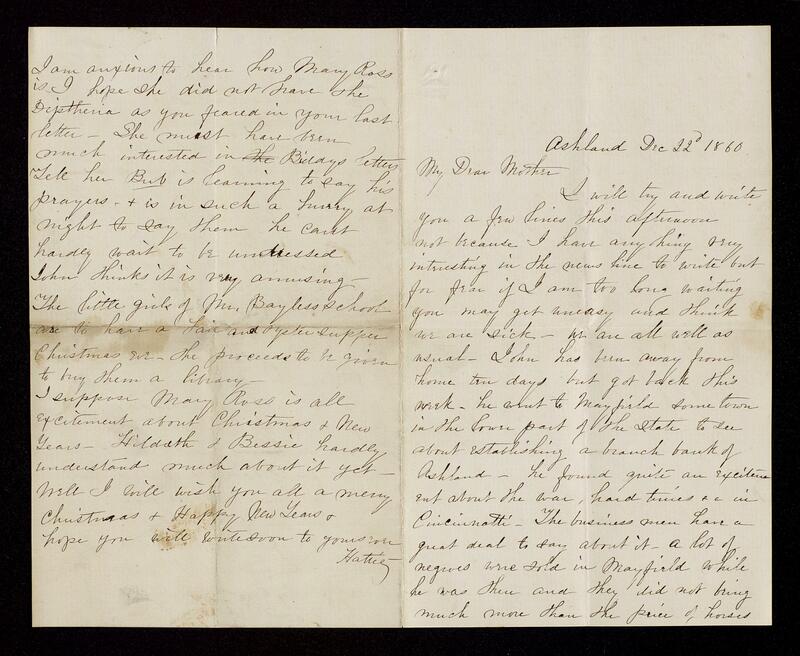 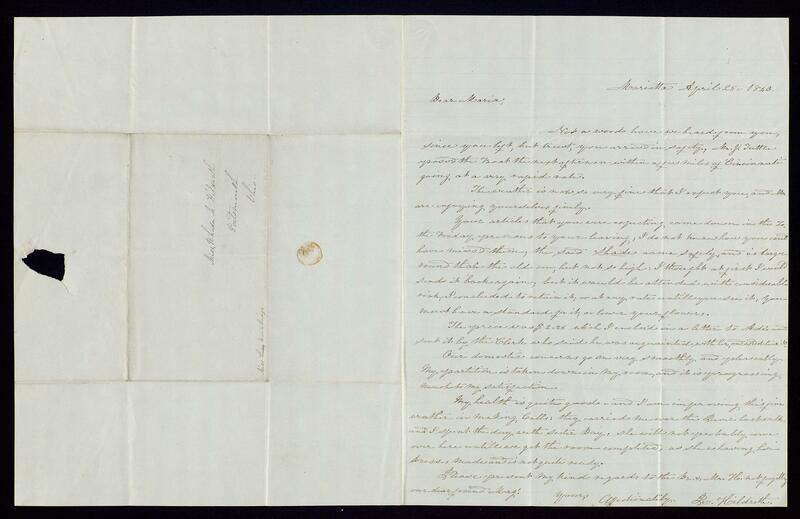 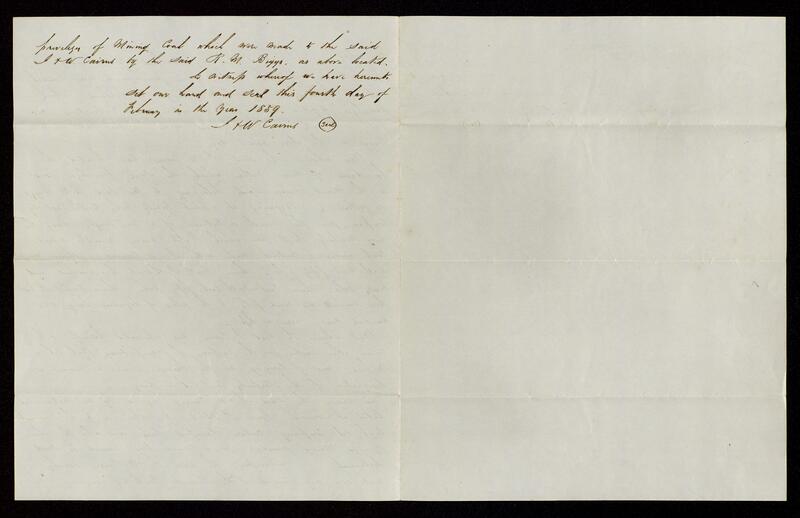 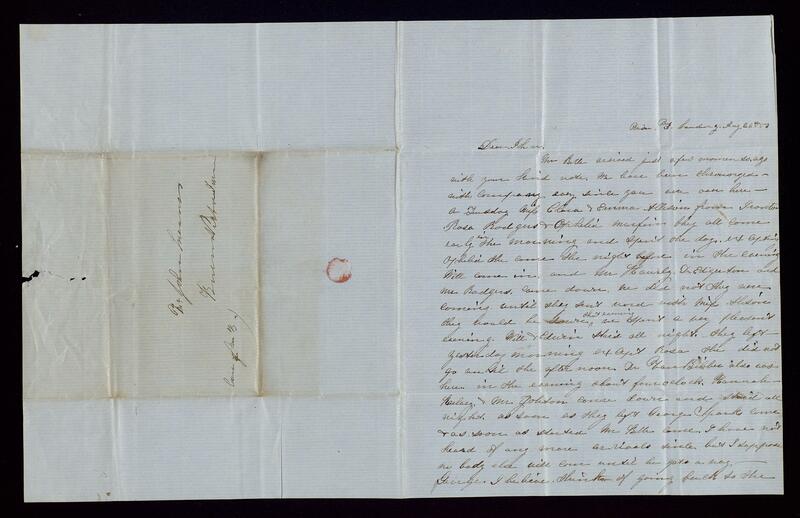 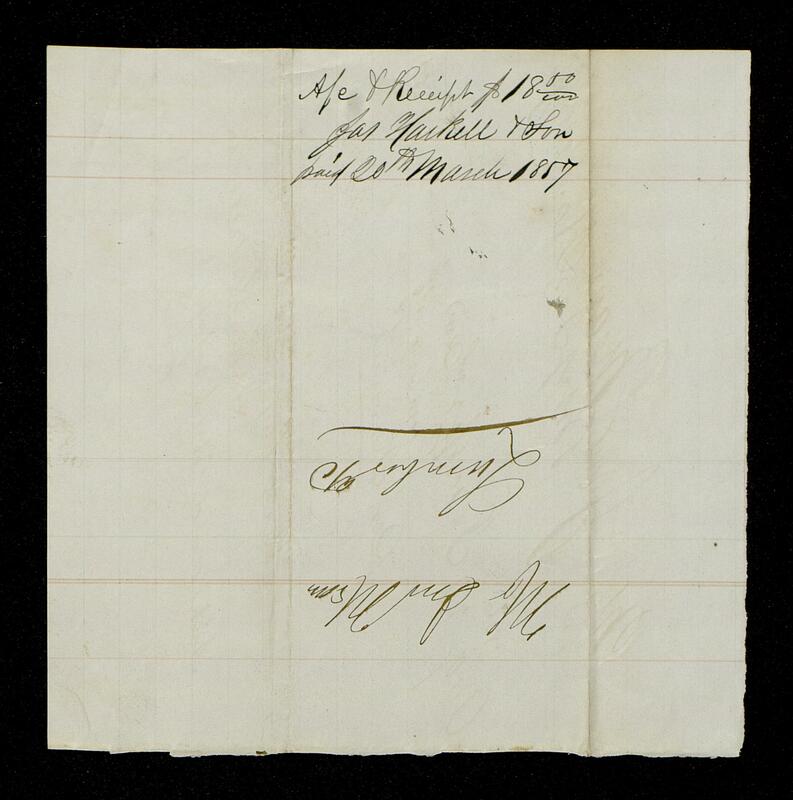 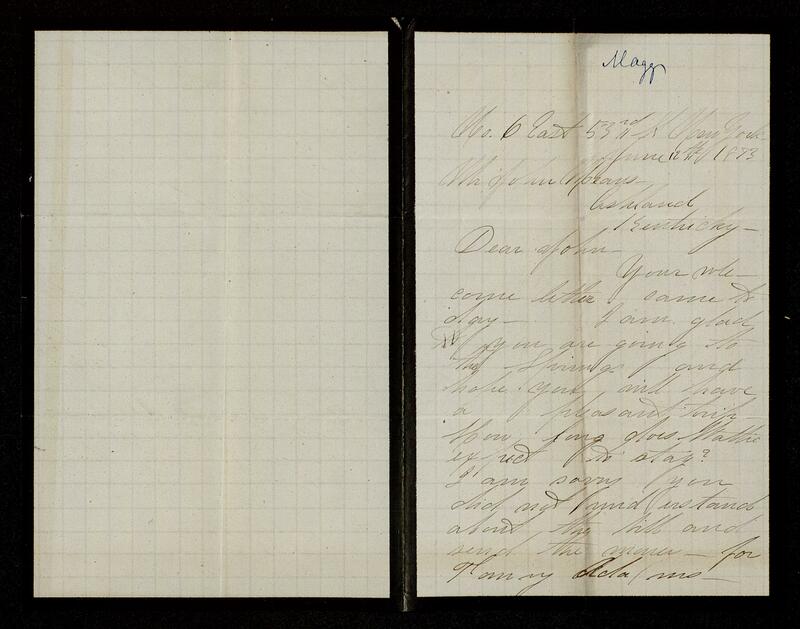 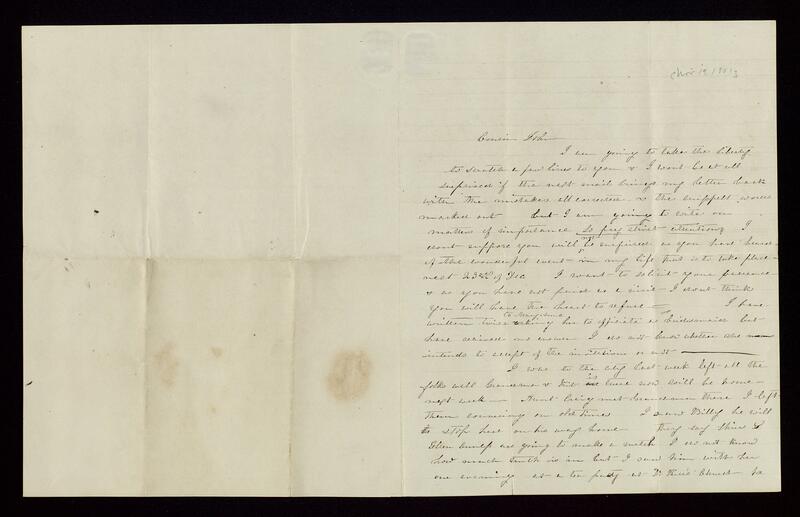 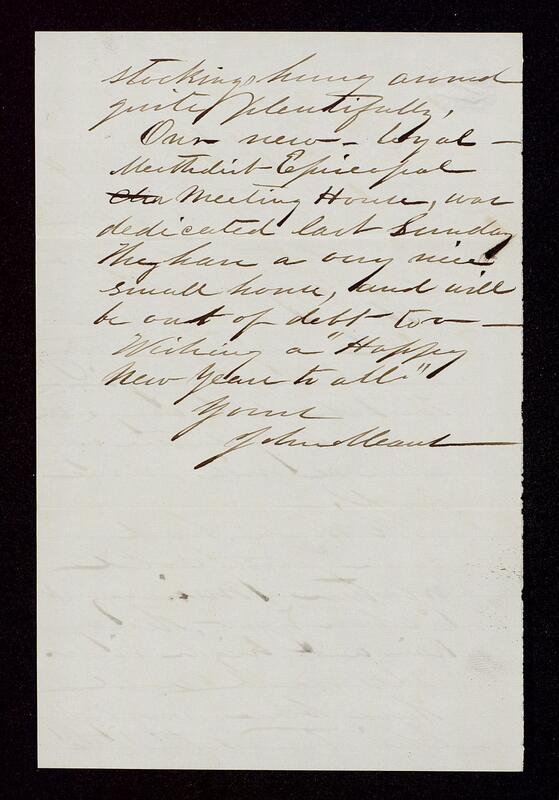 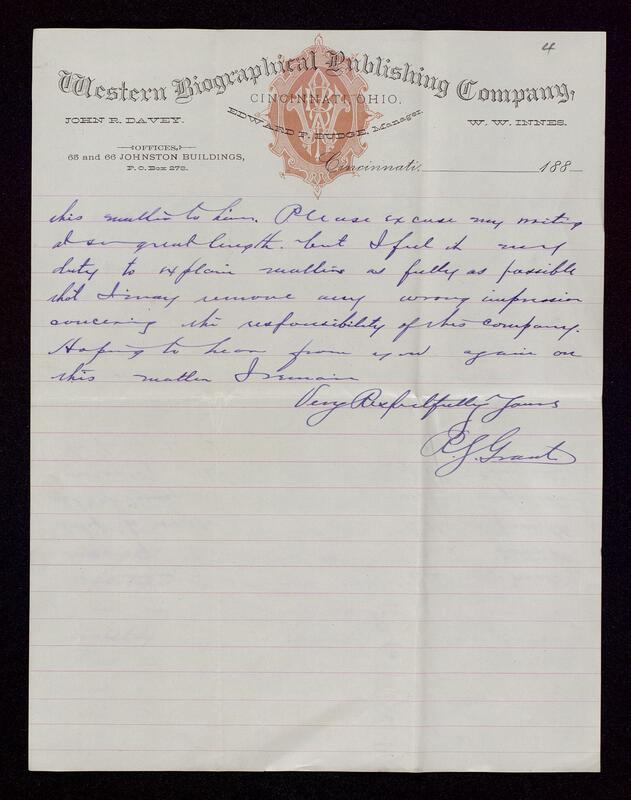 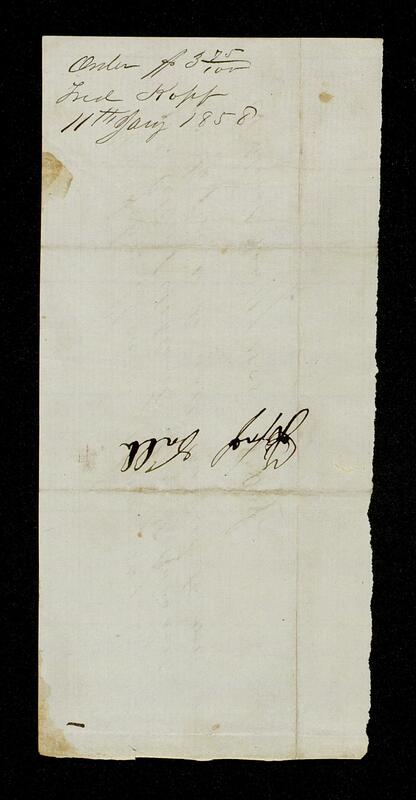 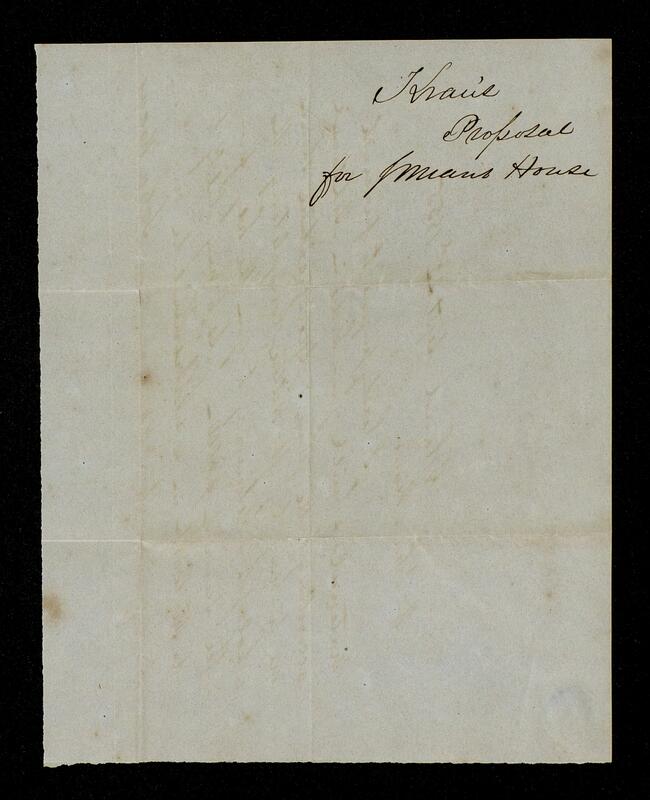 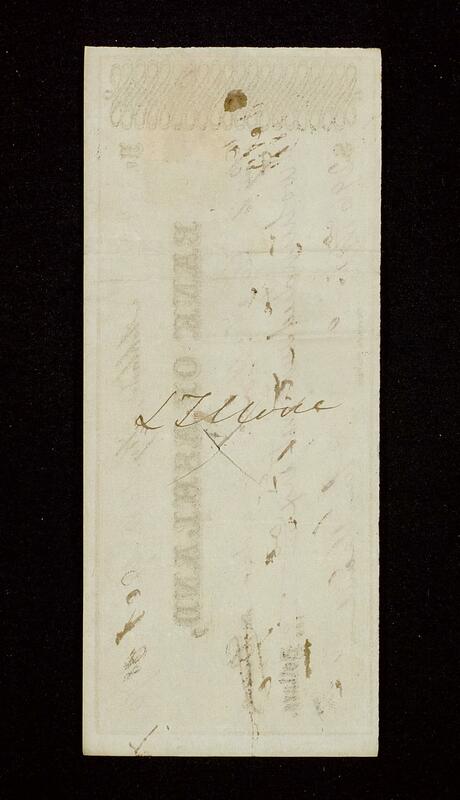 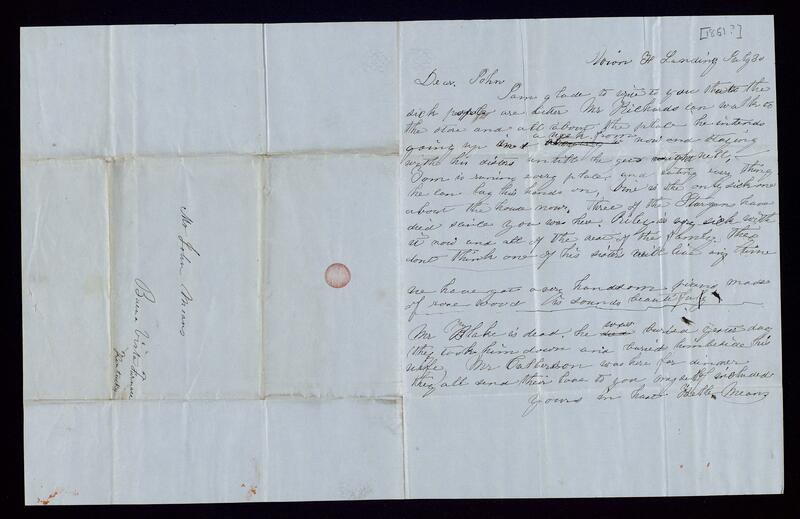 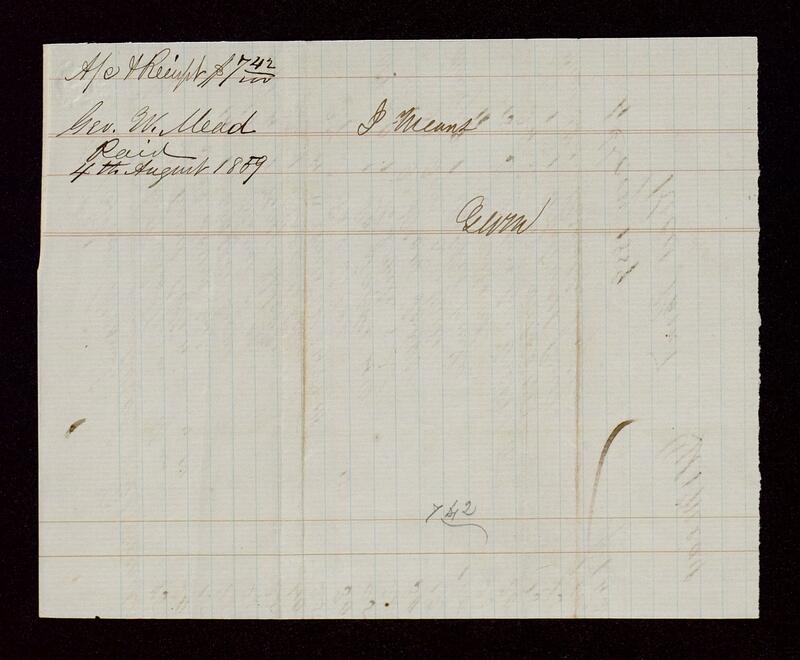 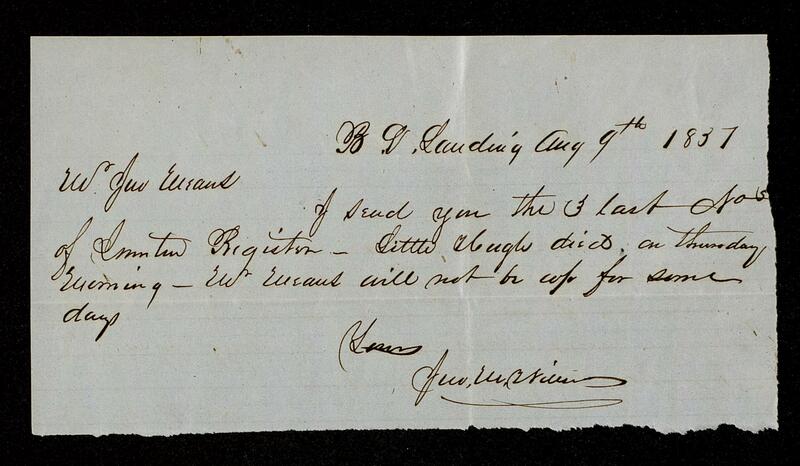 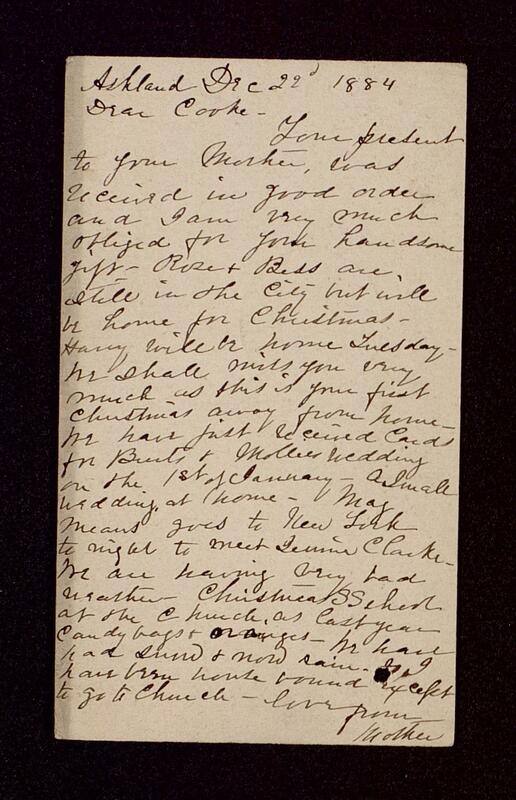 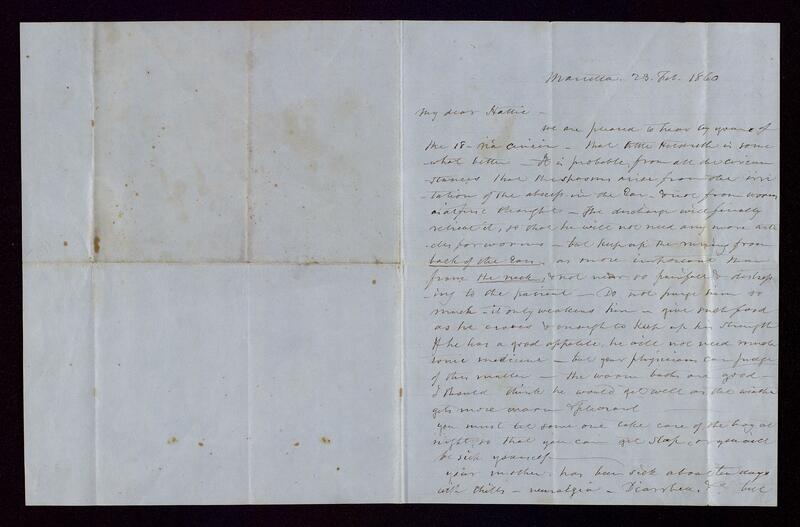 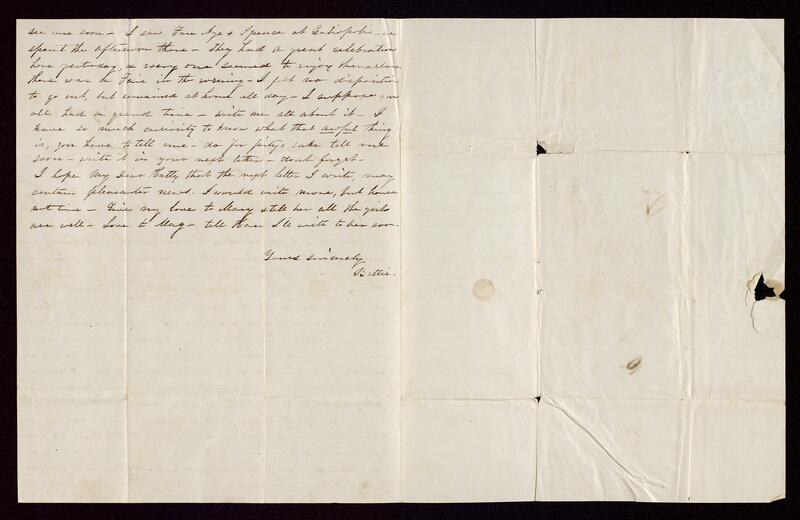 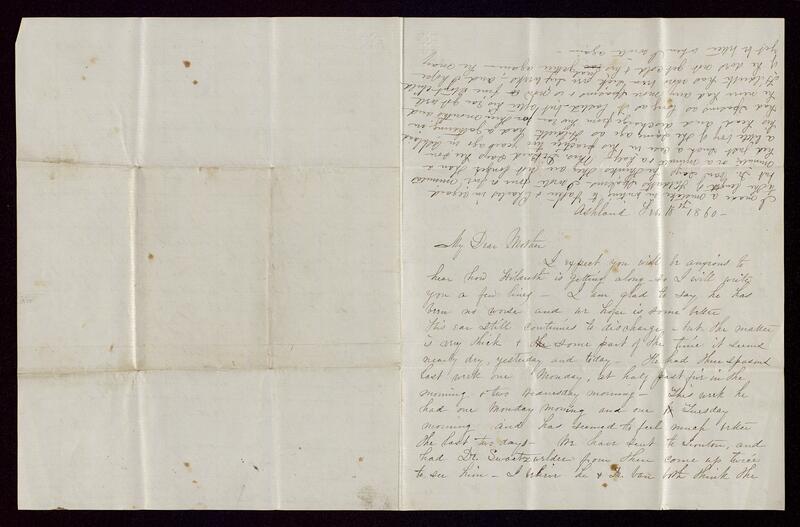 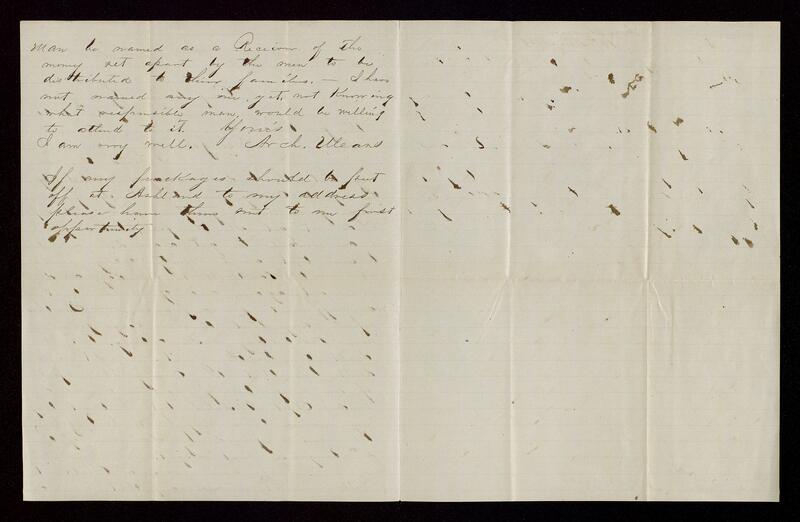 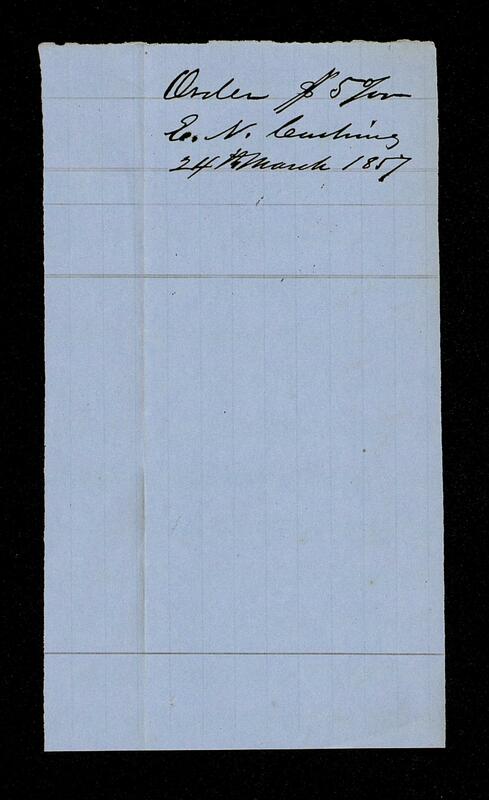 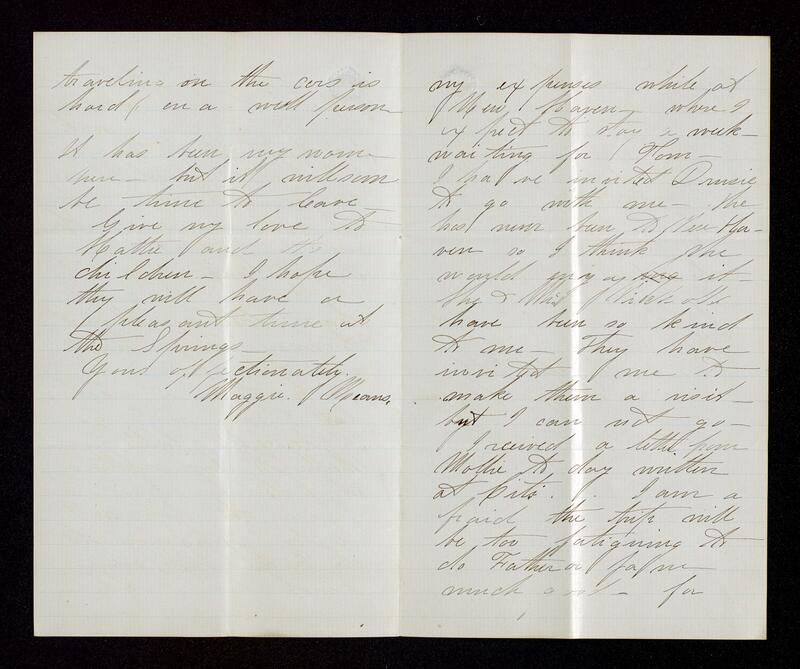 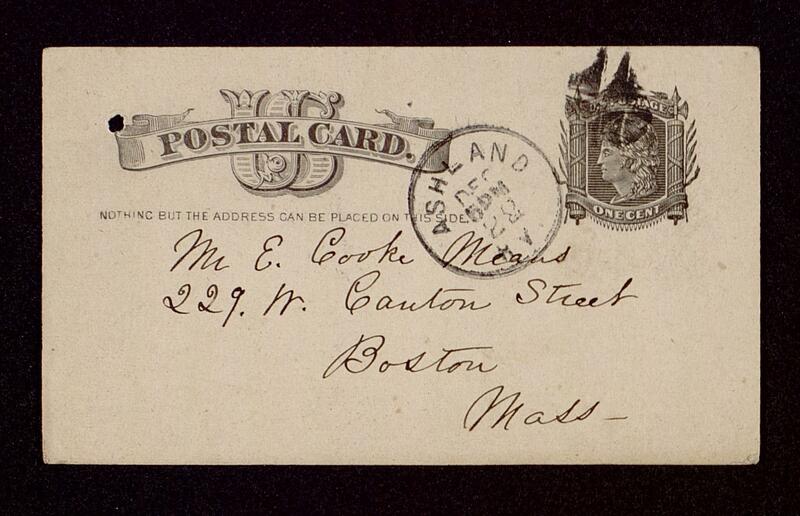 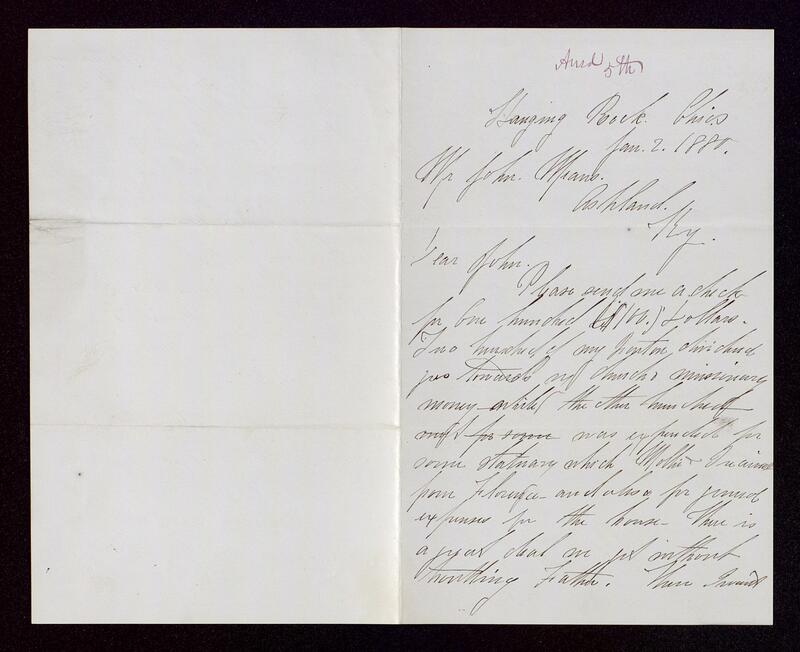 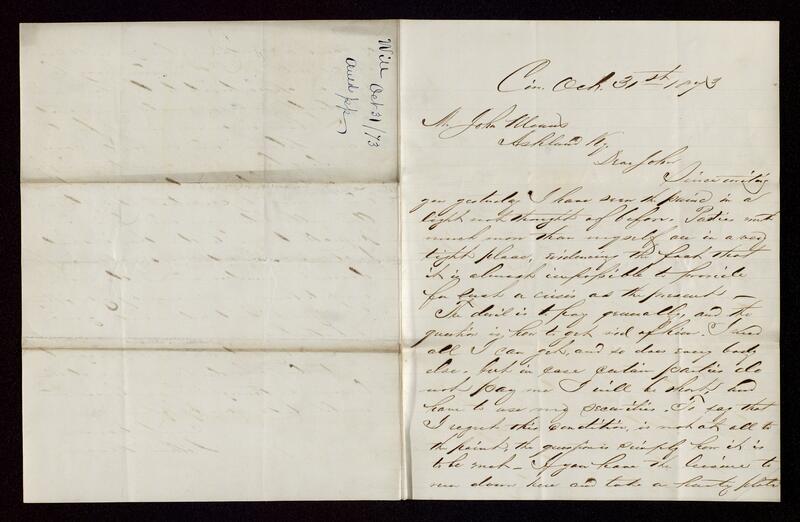 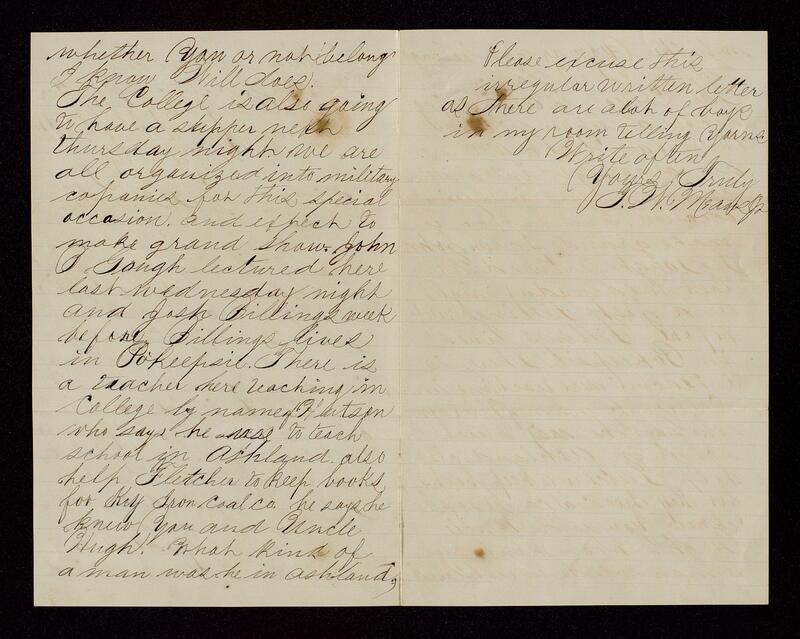 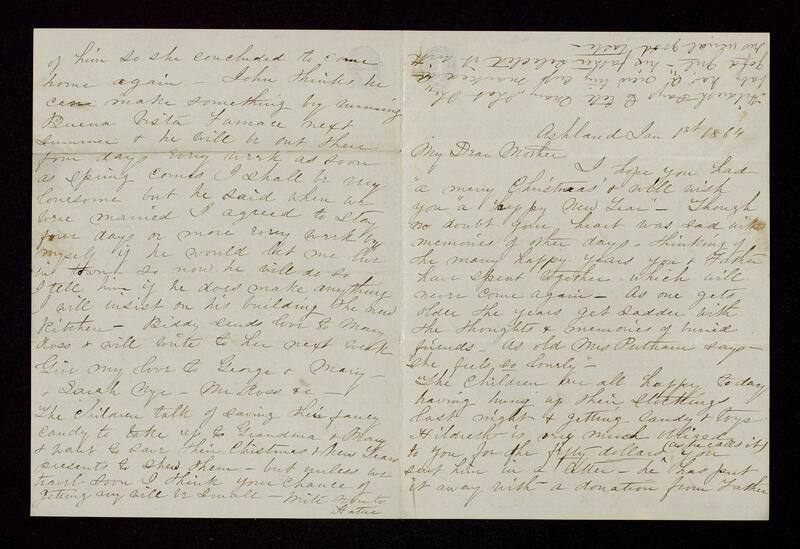 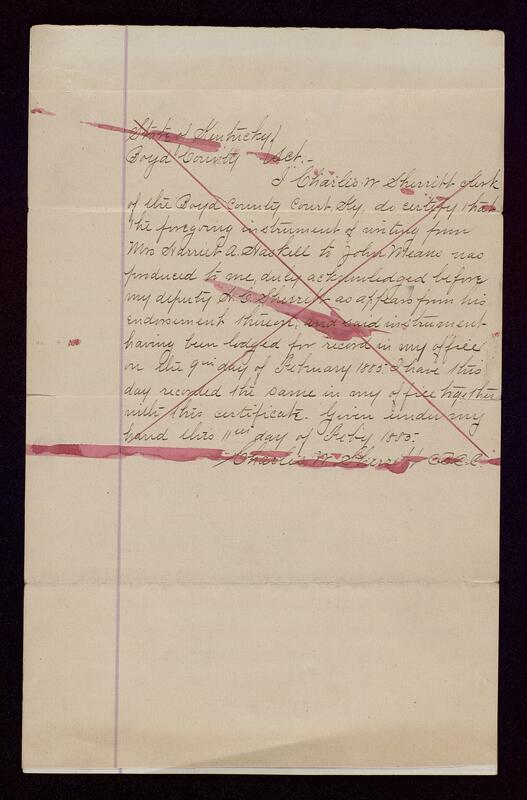 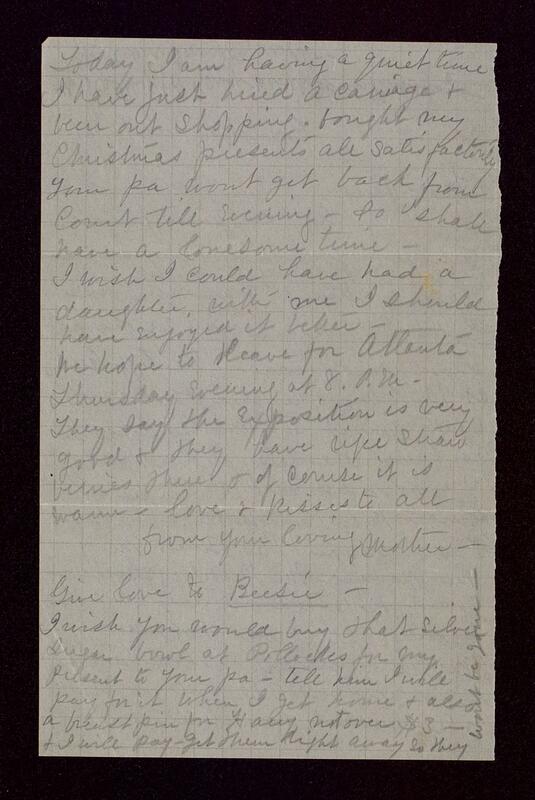 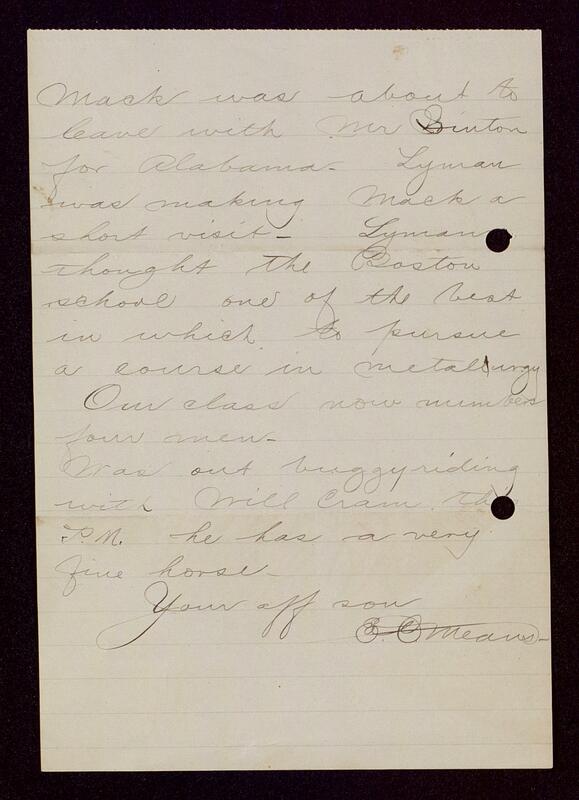 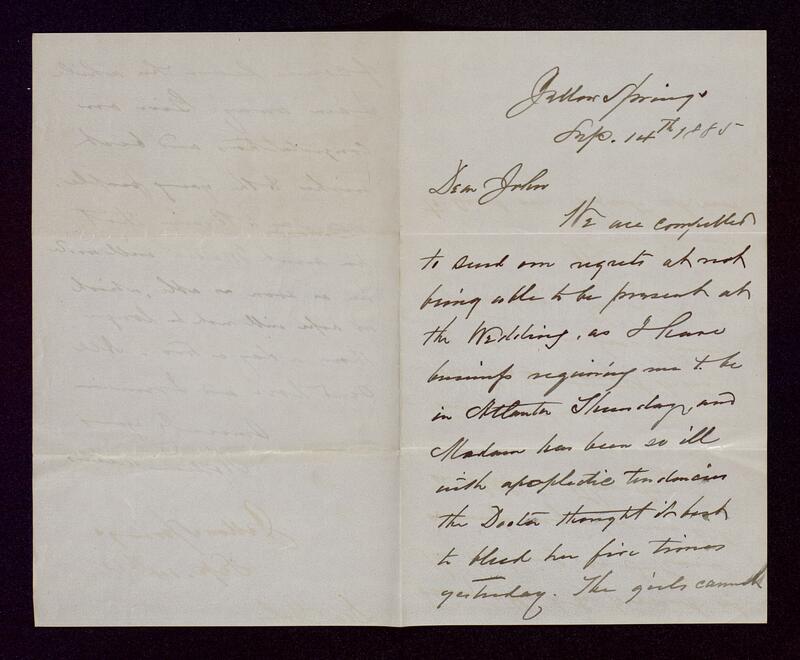 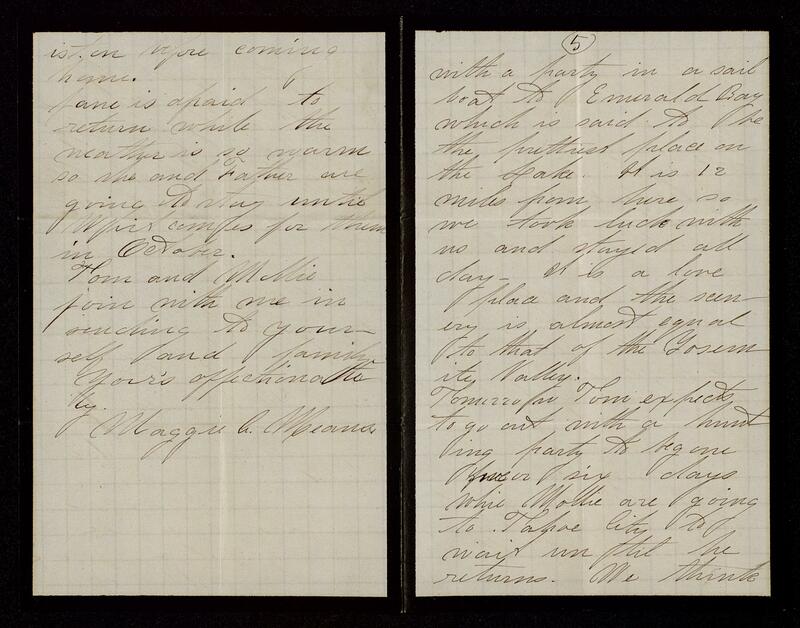 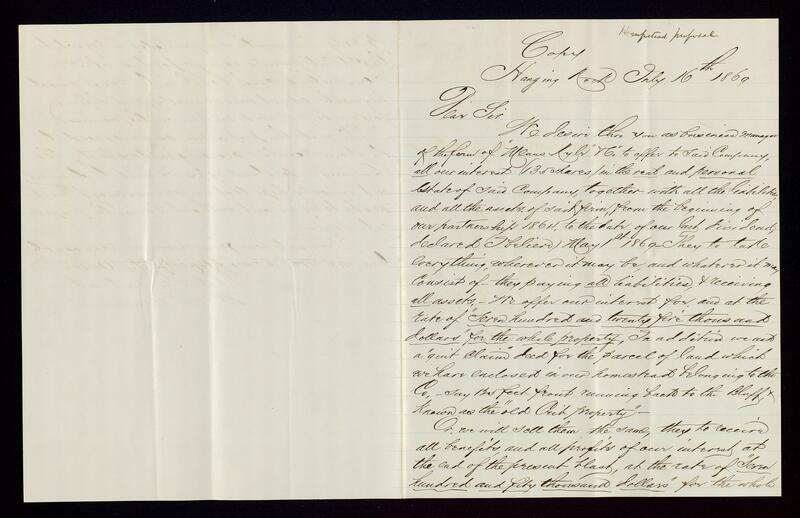 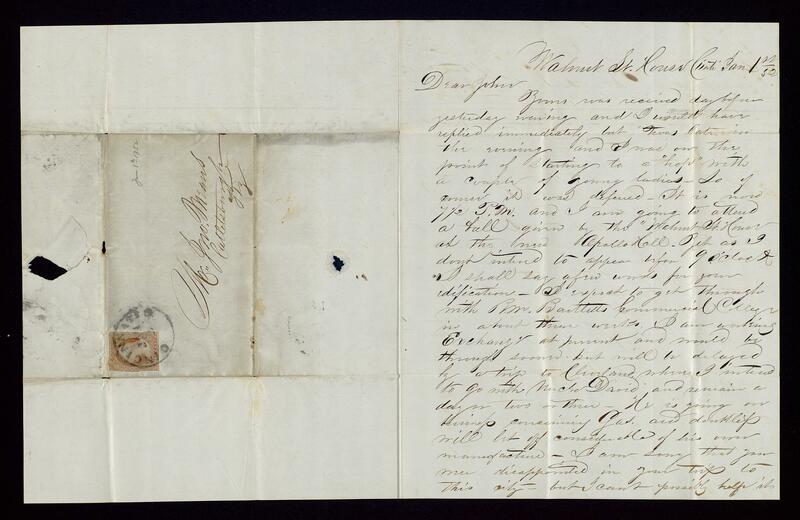 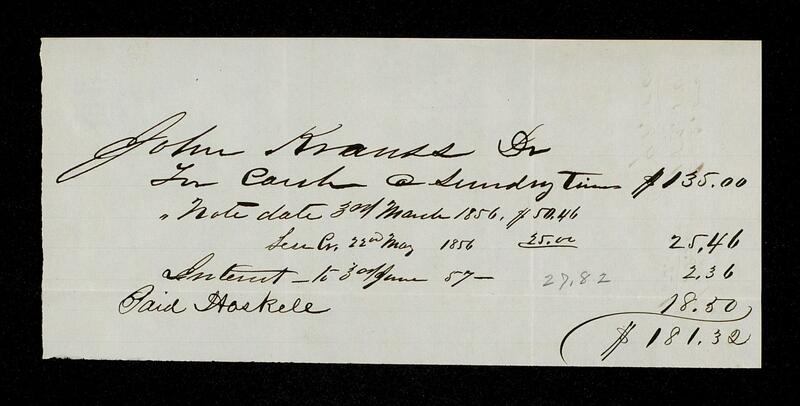 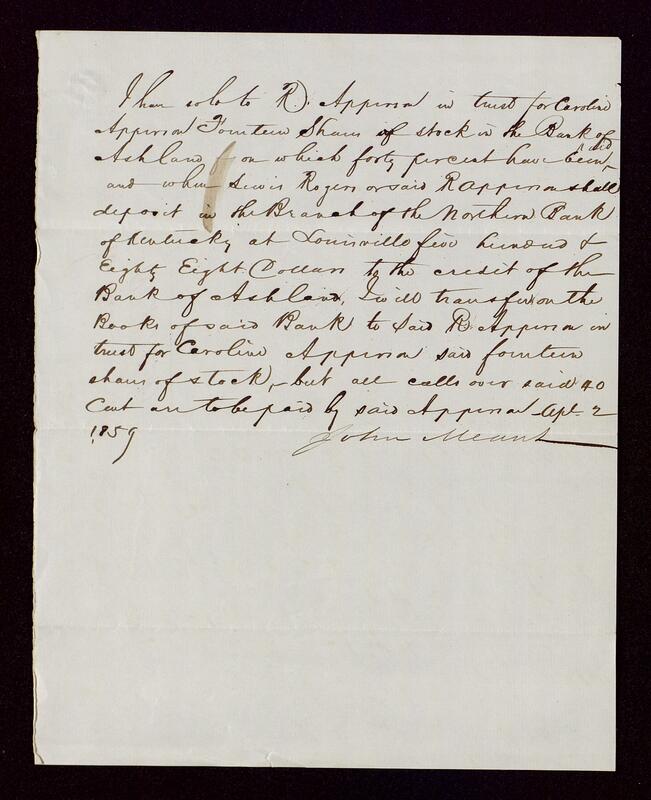 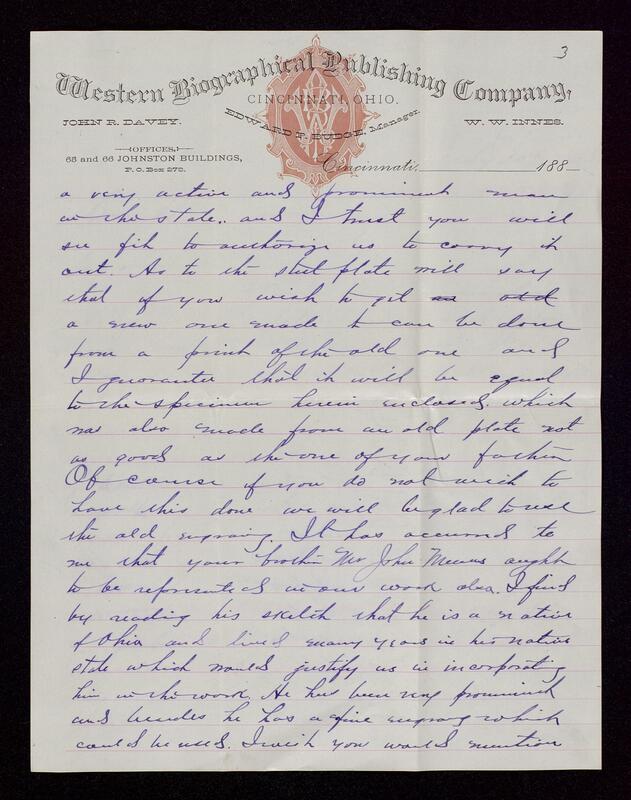 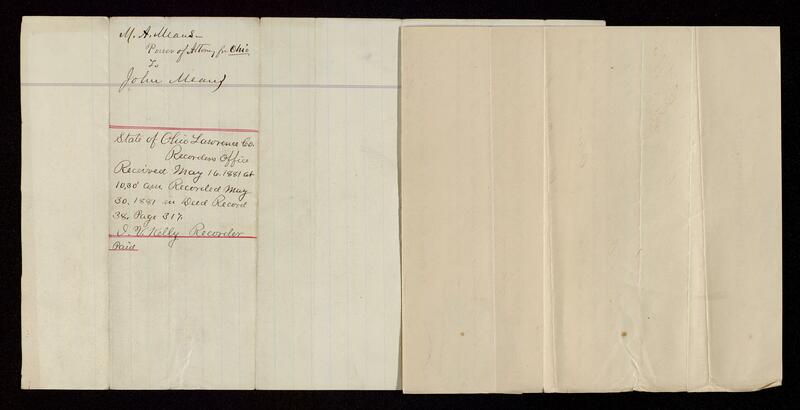 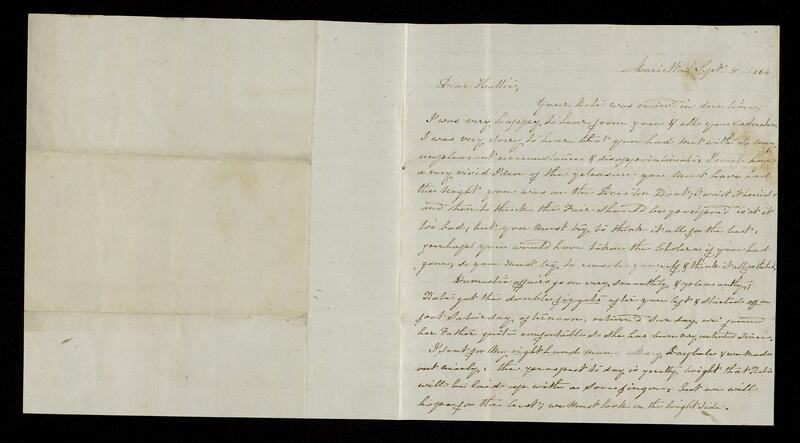 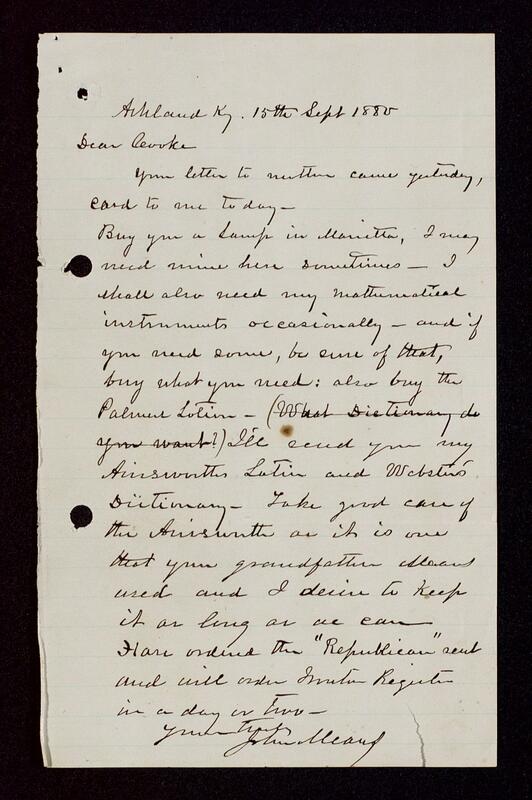 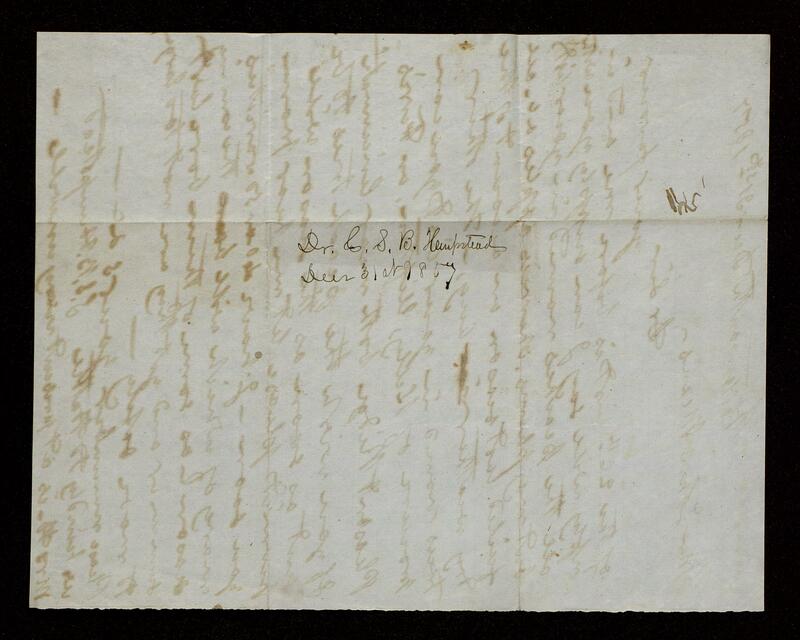 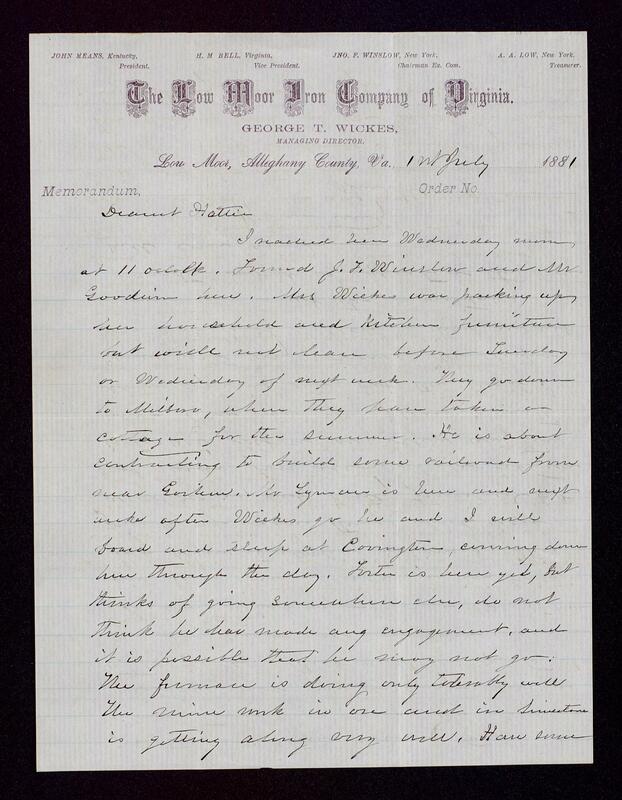 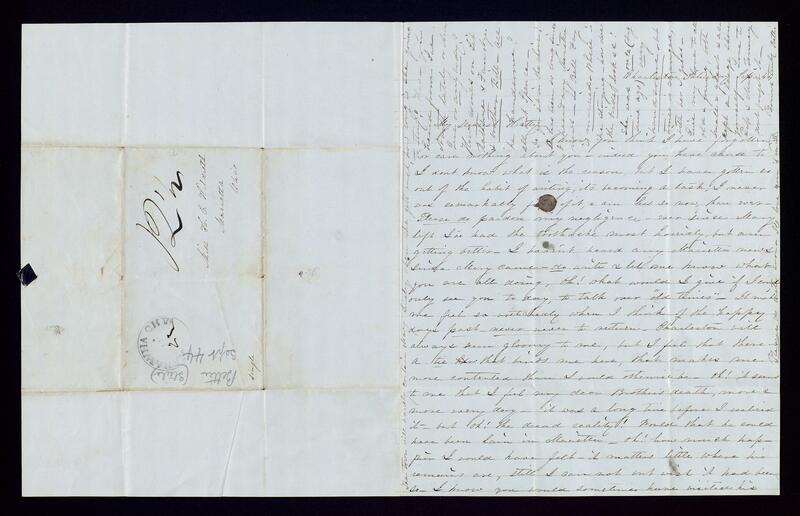 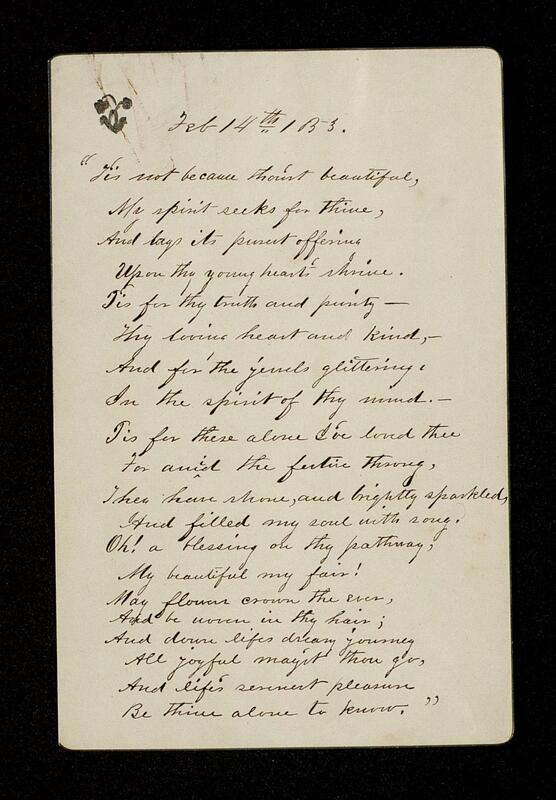 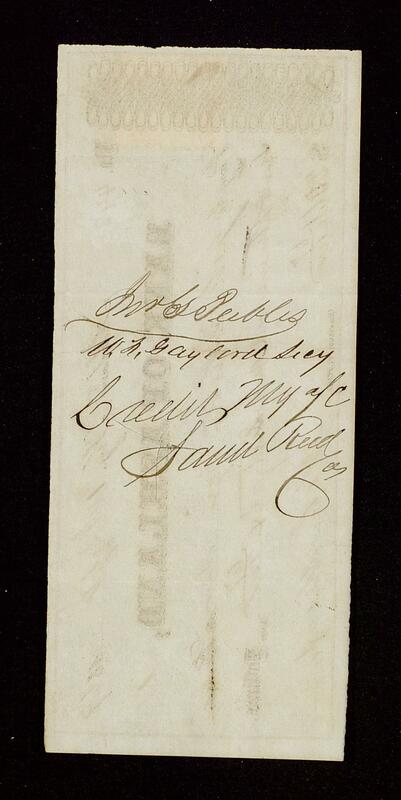 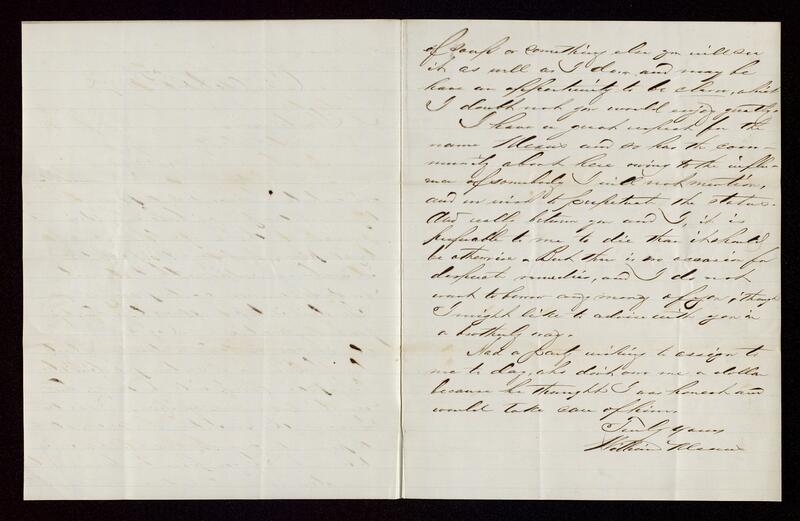 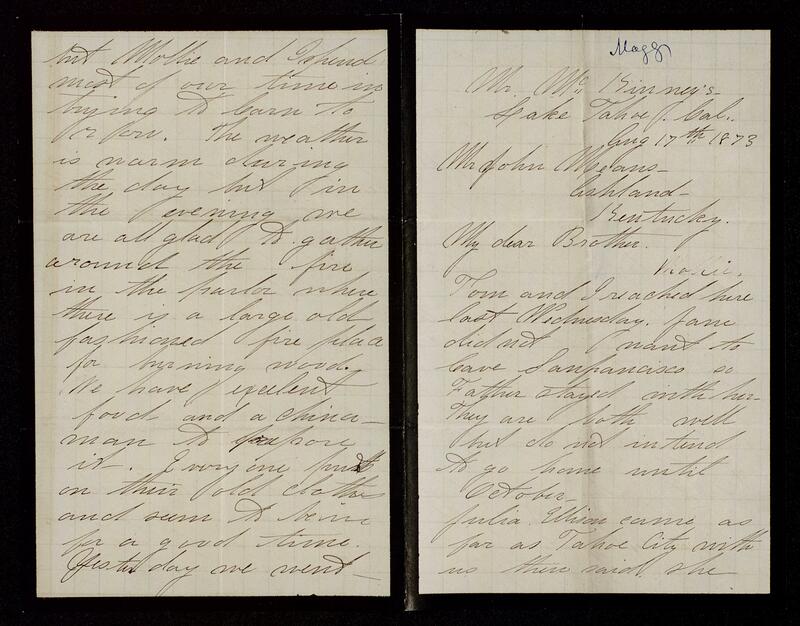 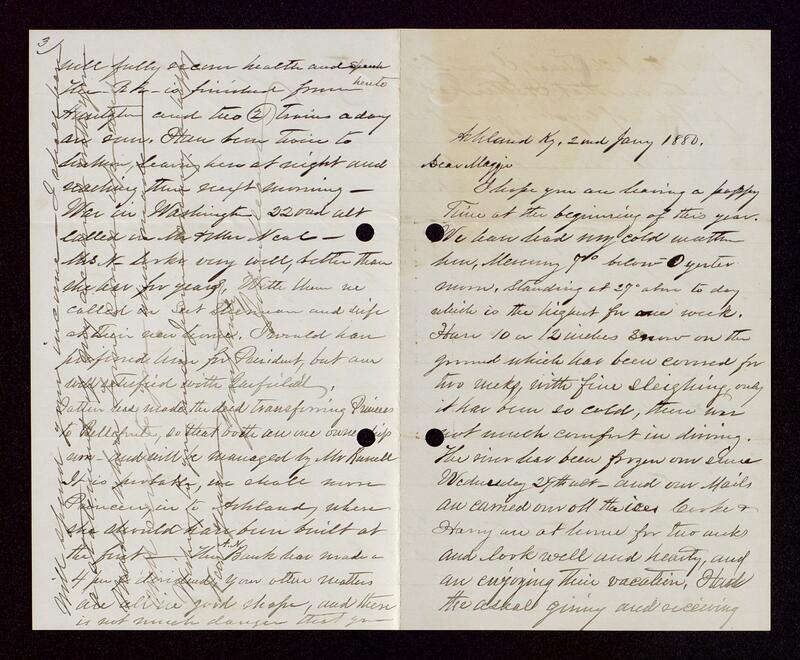 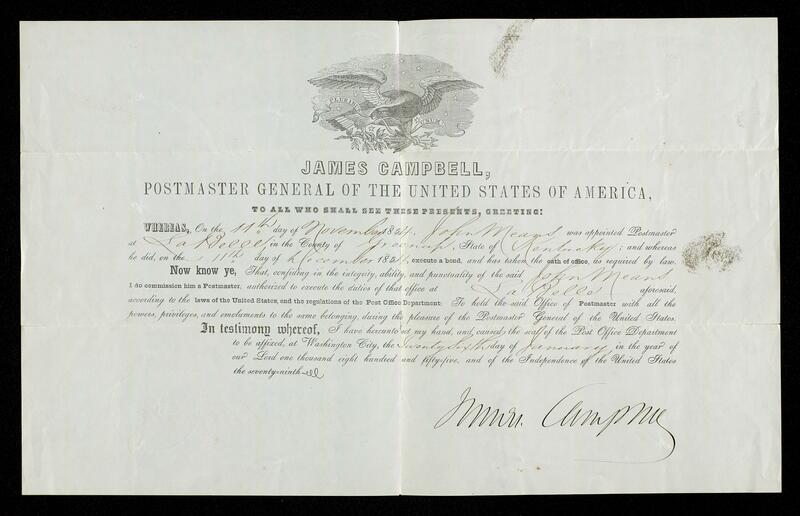 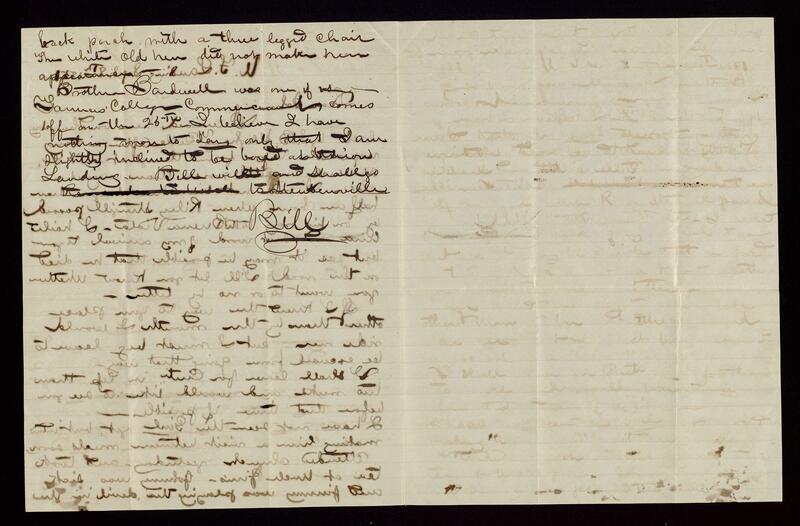 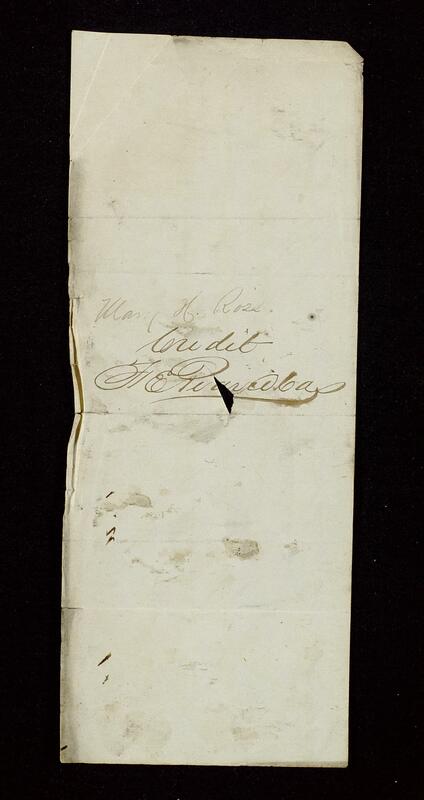 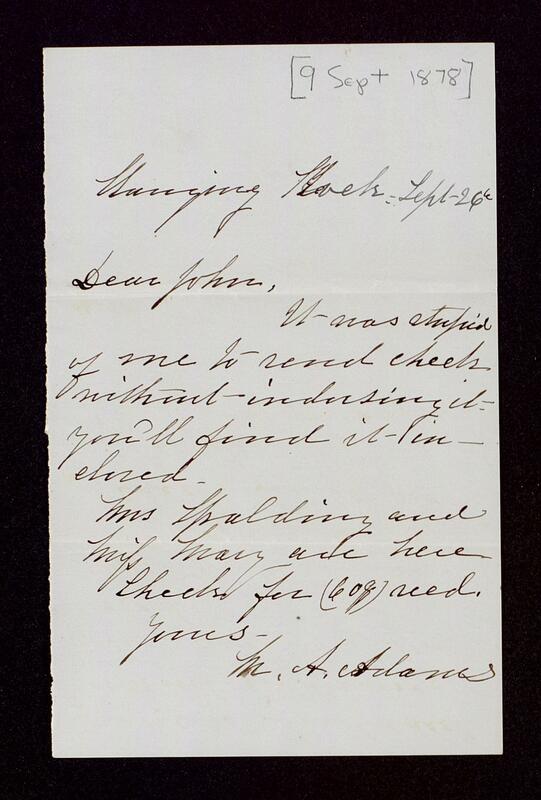 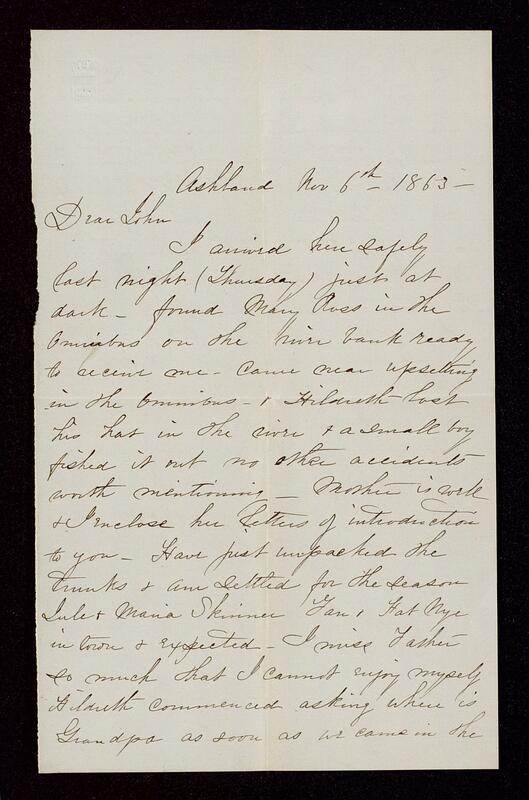 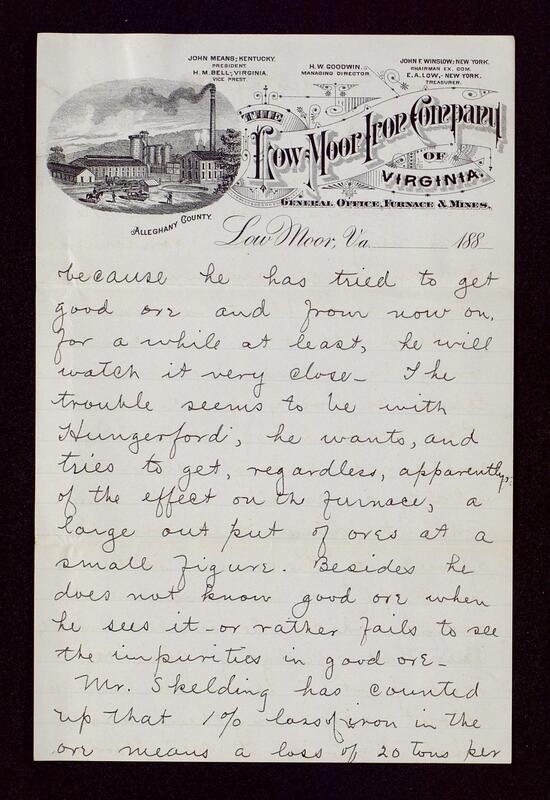 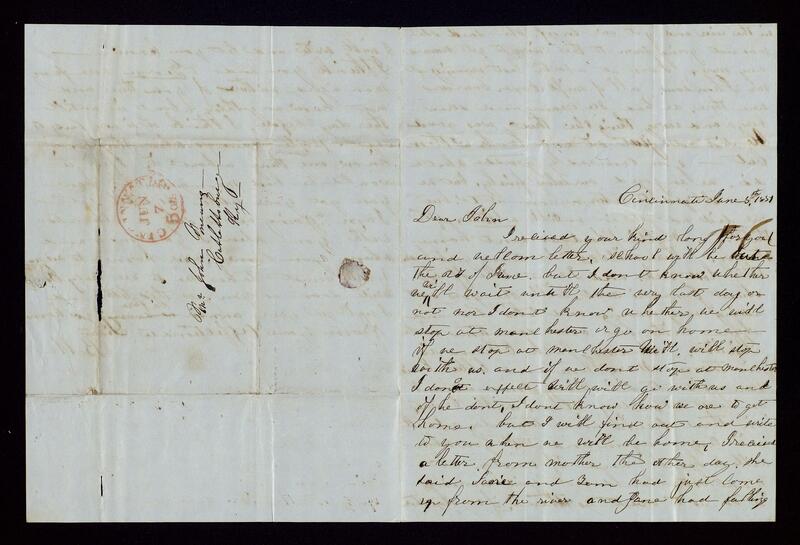 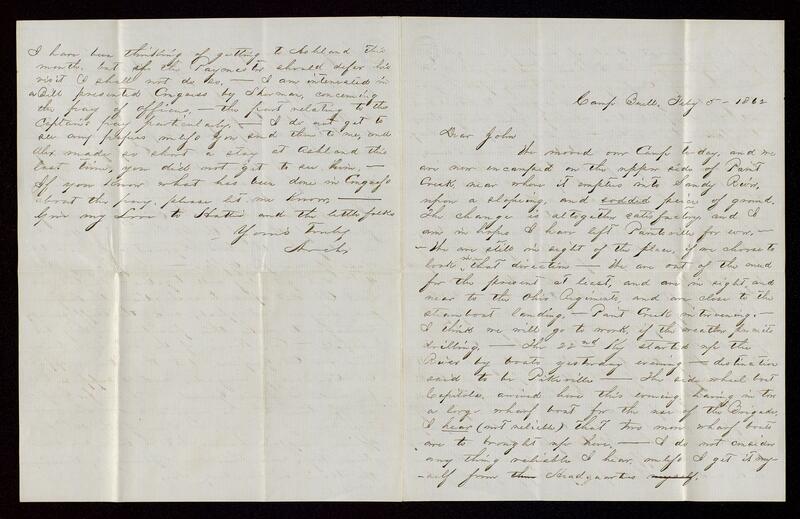 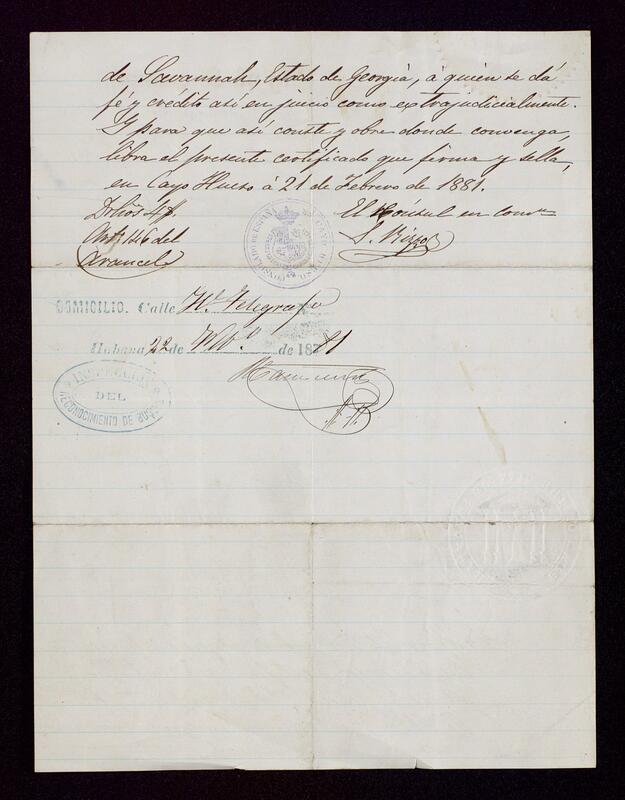 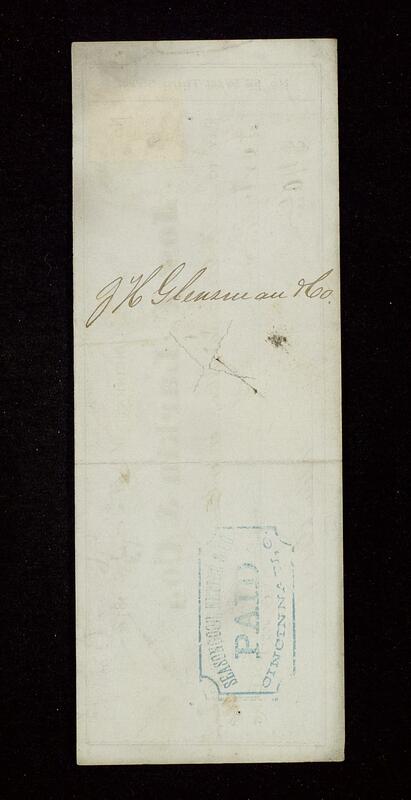 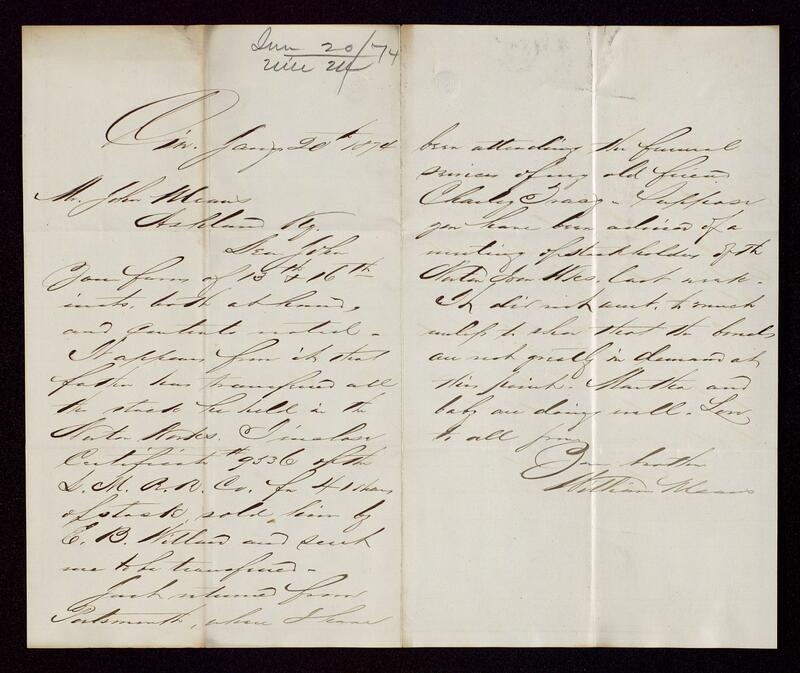 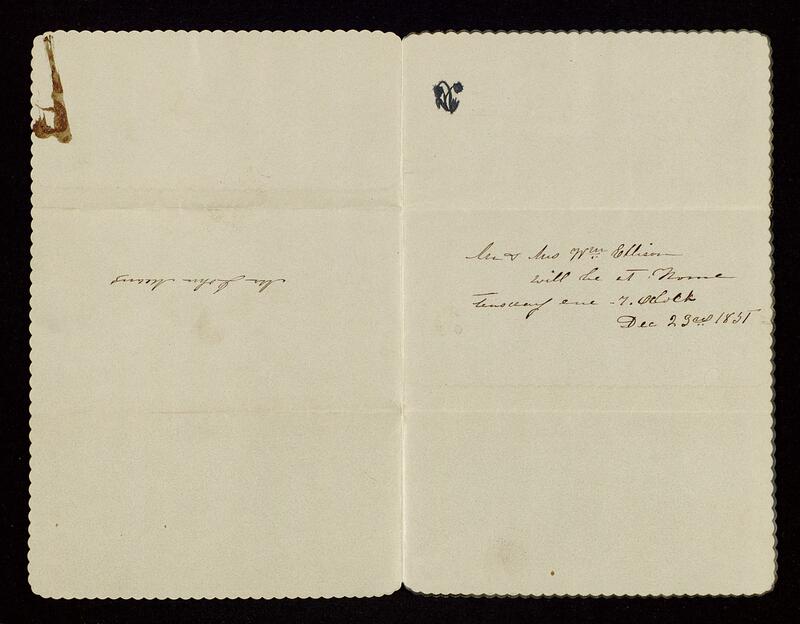 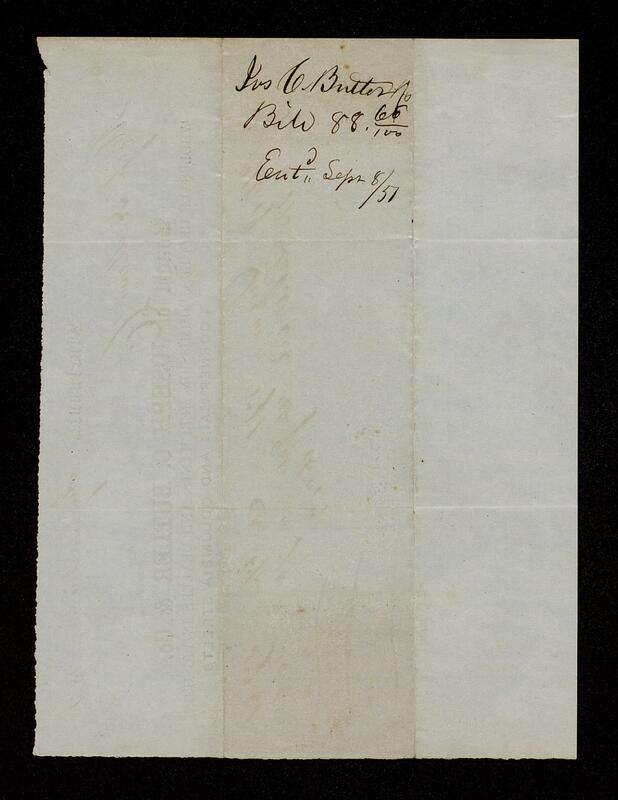 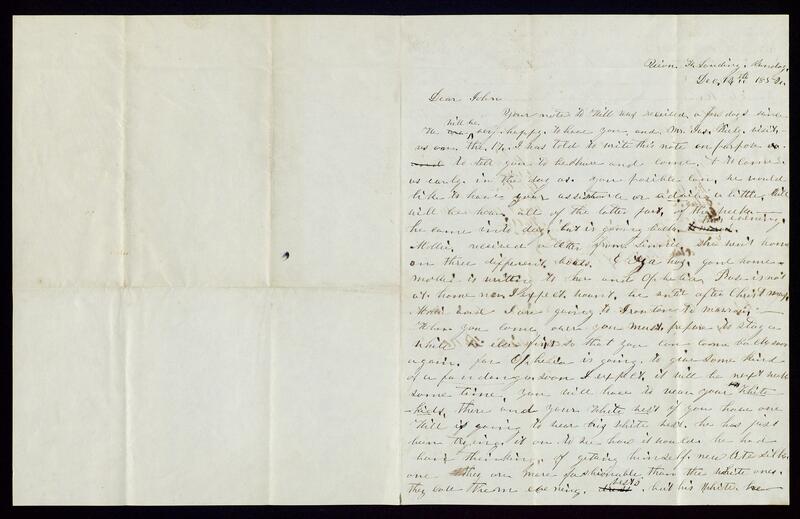 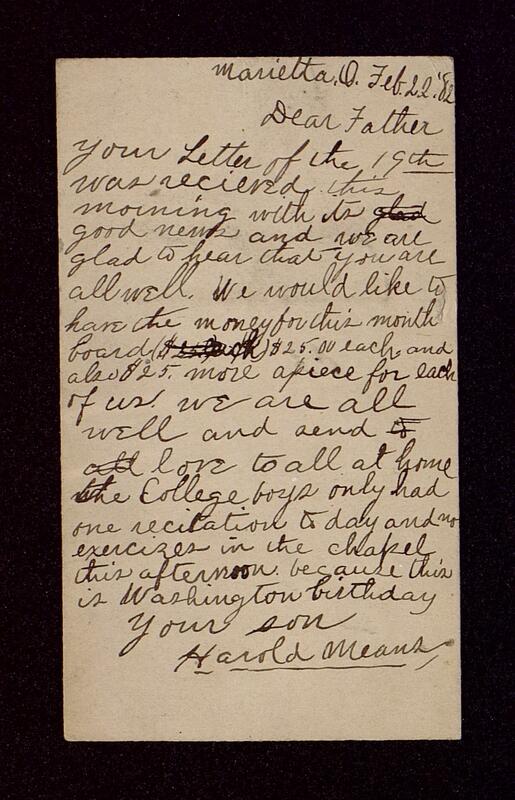 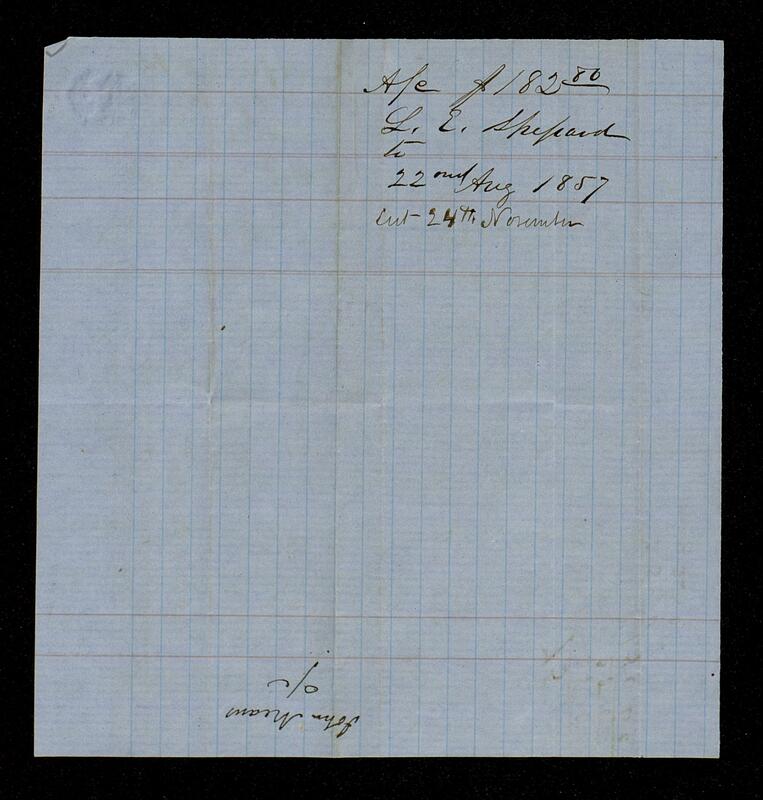 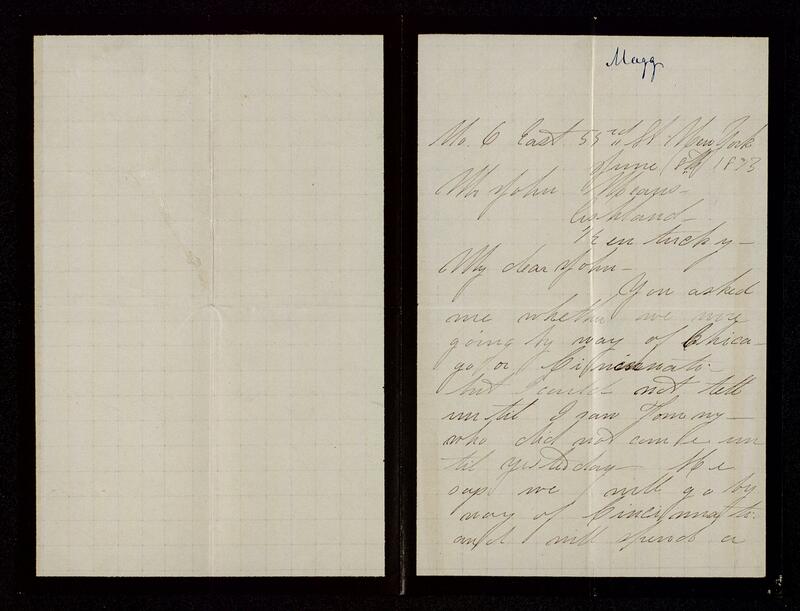 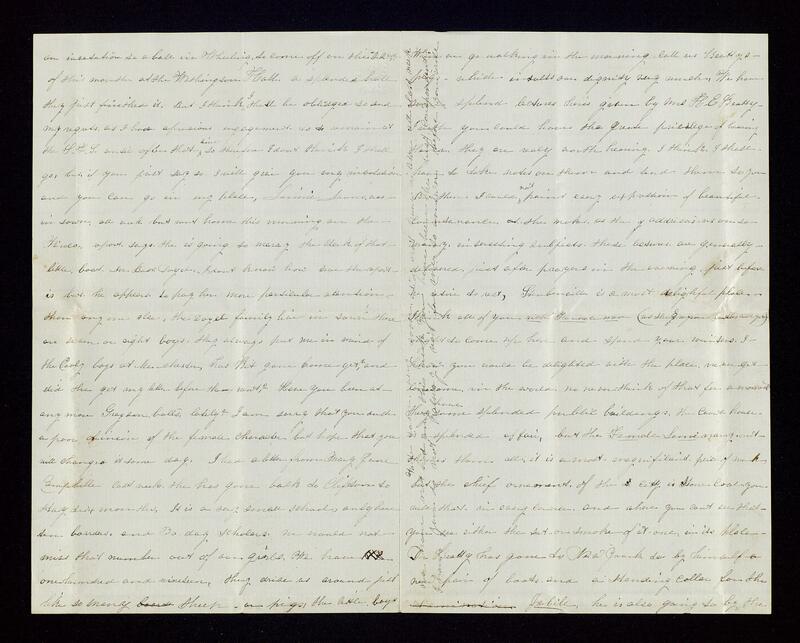 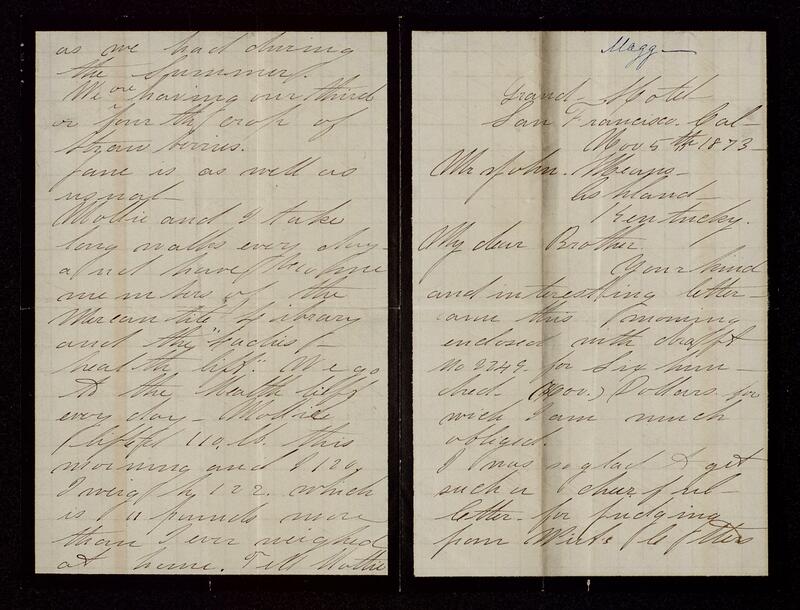 This period includes correspondence from E.C. 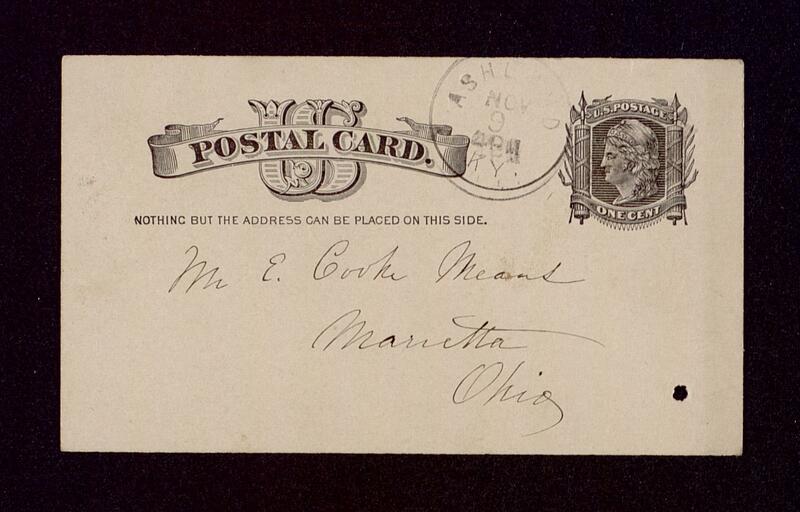 Cooke while in school at Marietta College and later at the Massachusetts Institute of Technology, in which he comments on college life in the 1880s. 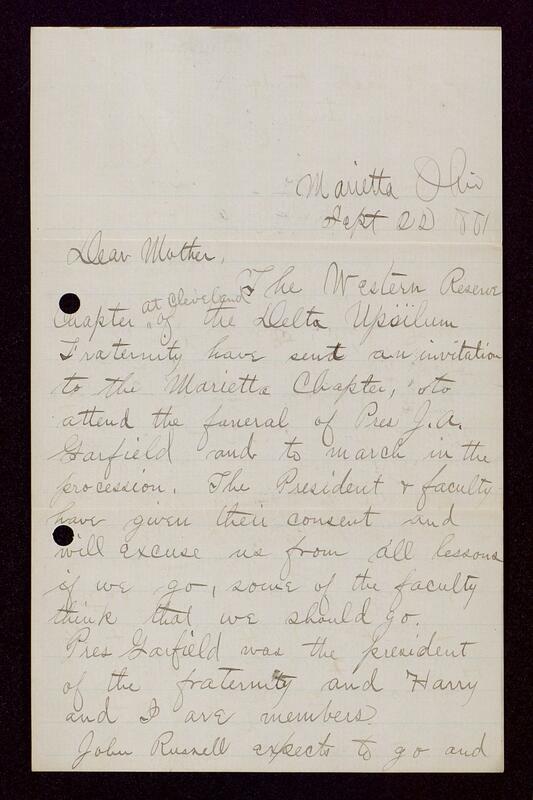 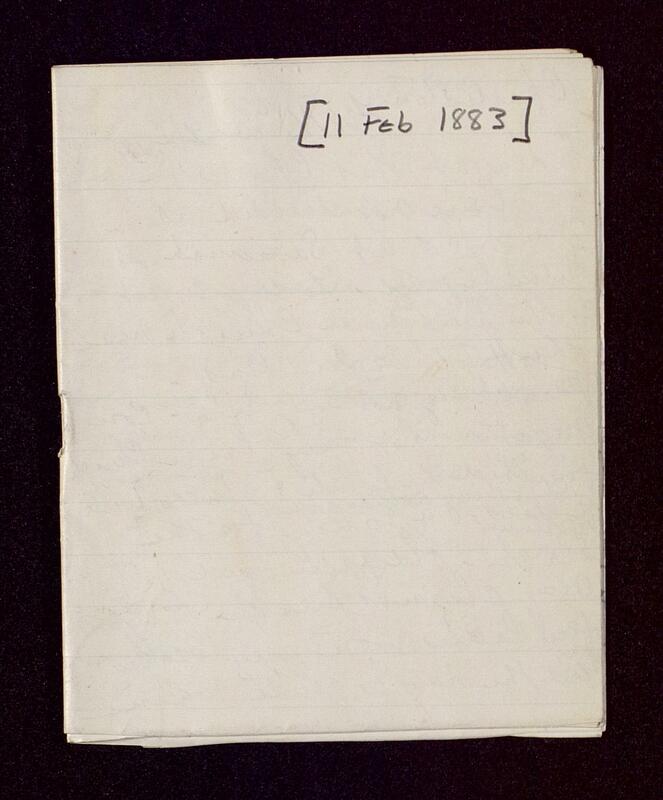 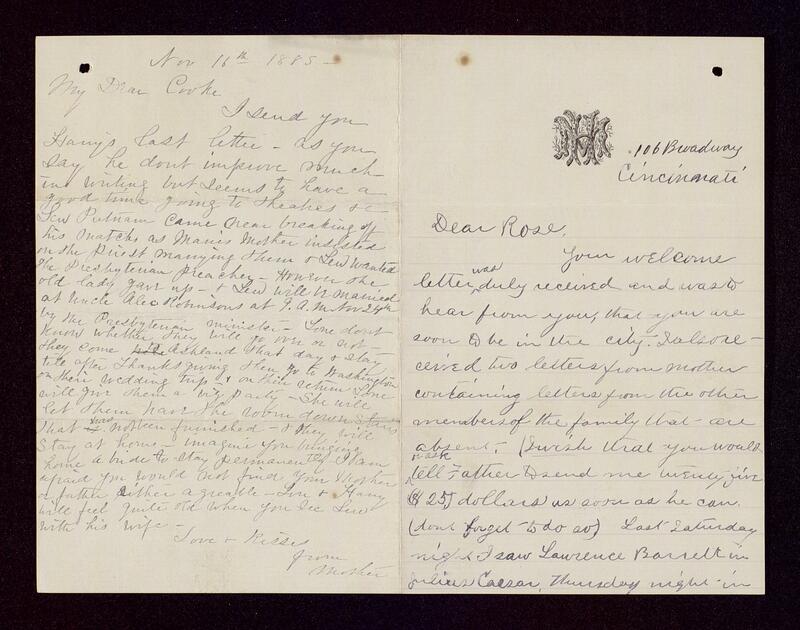 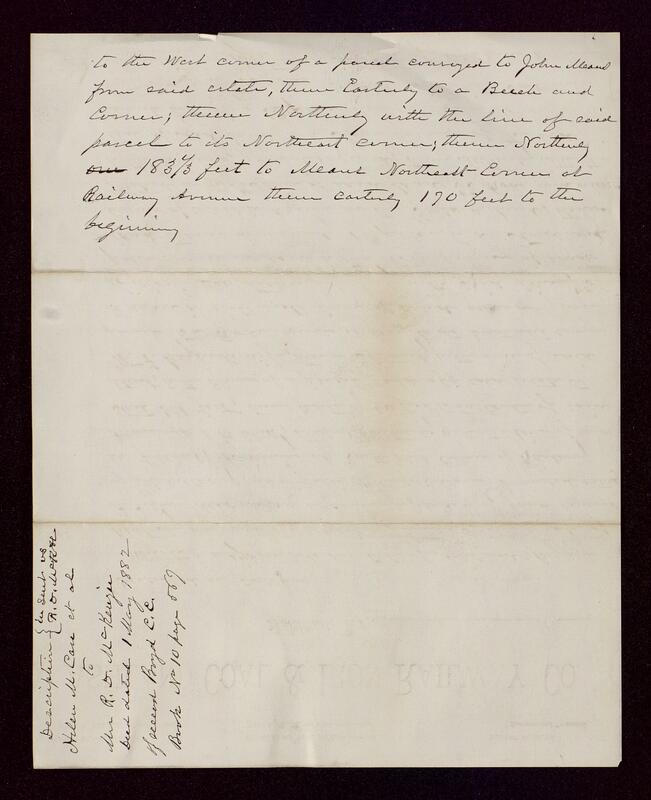 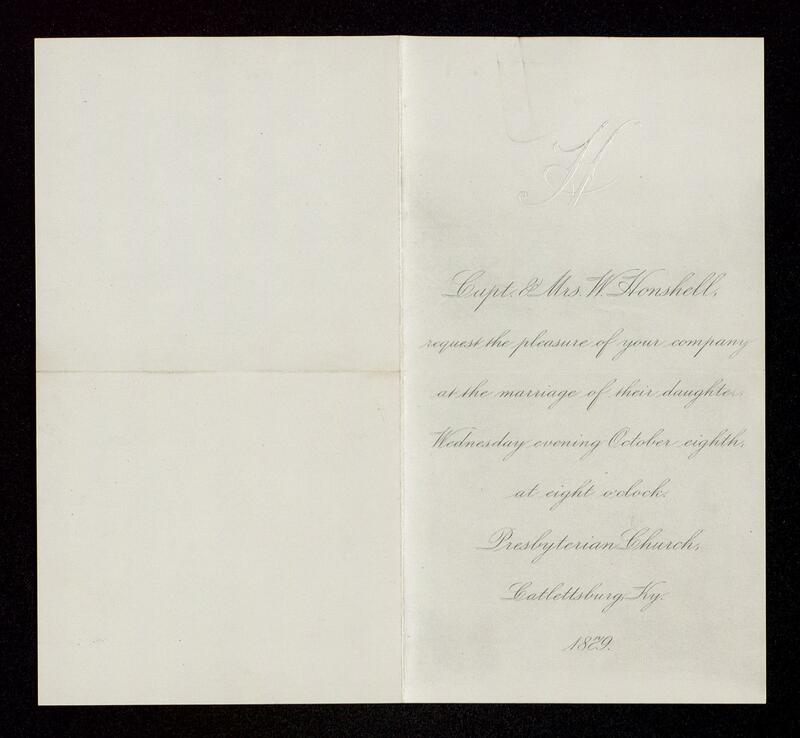 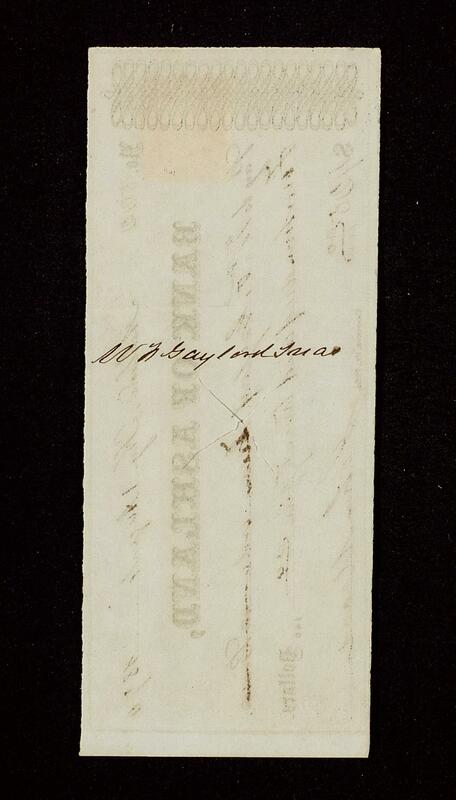 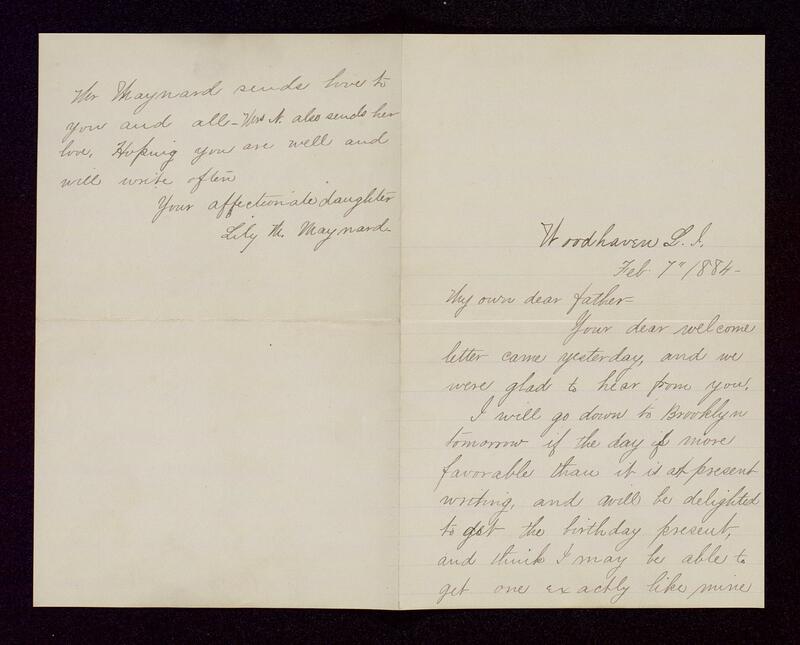 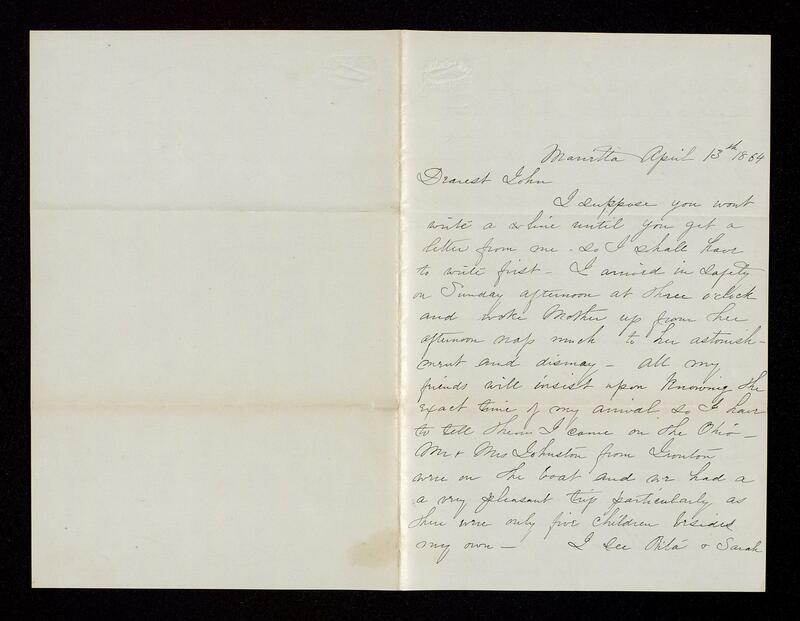 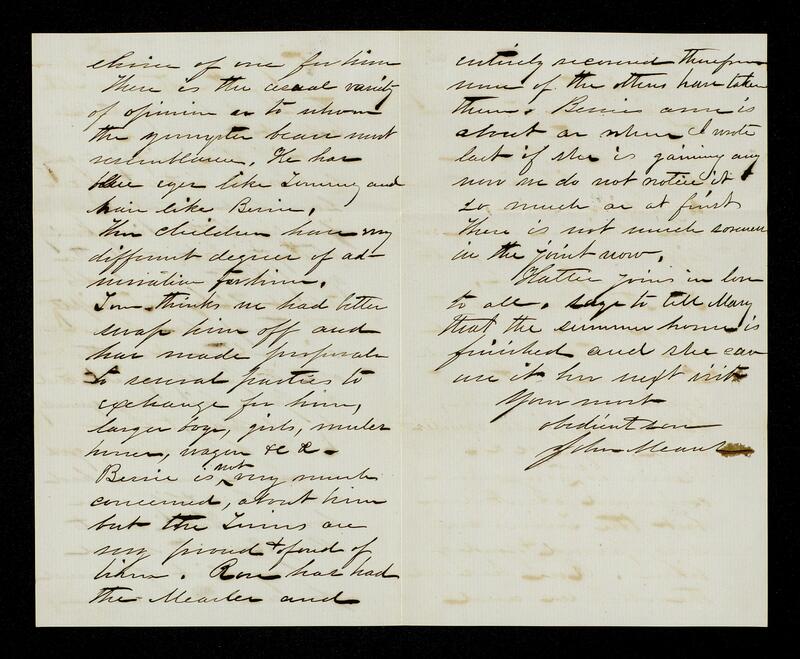 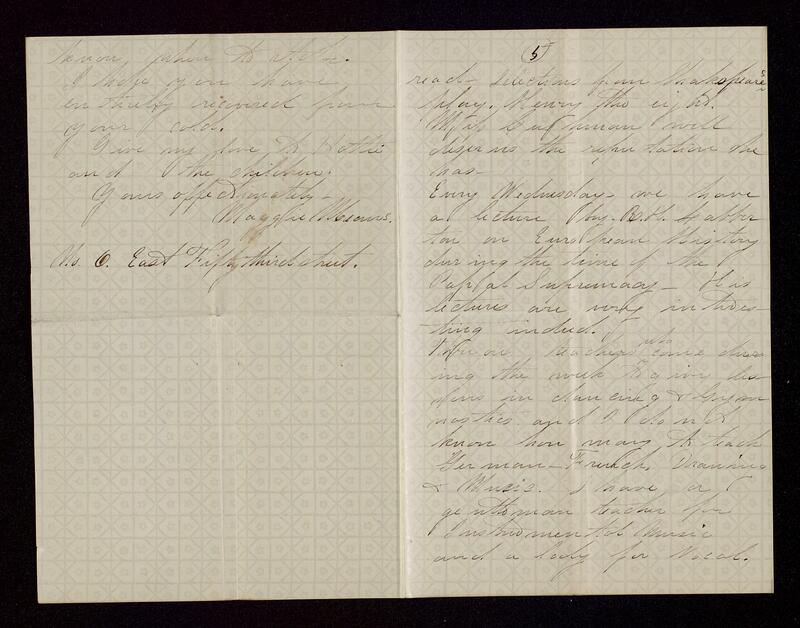 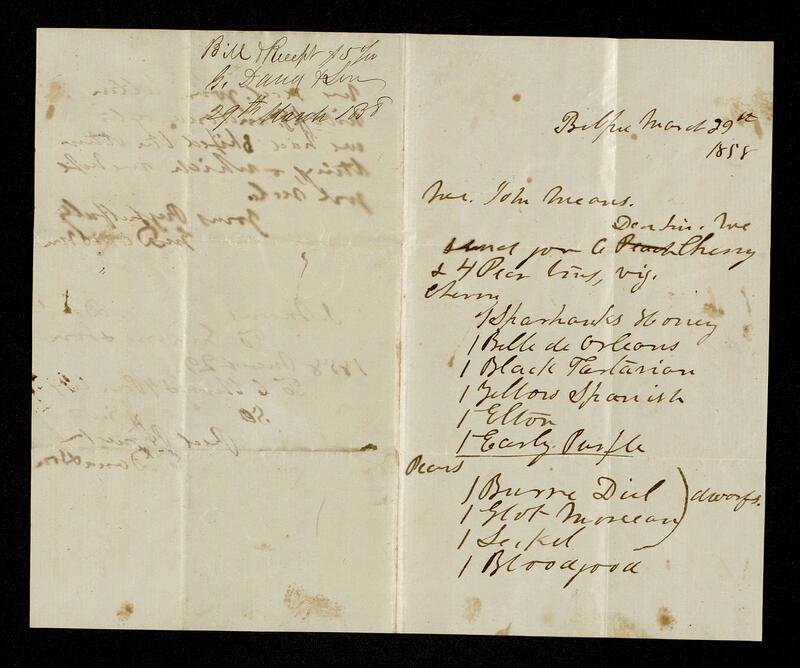 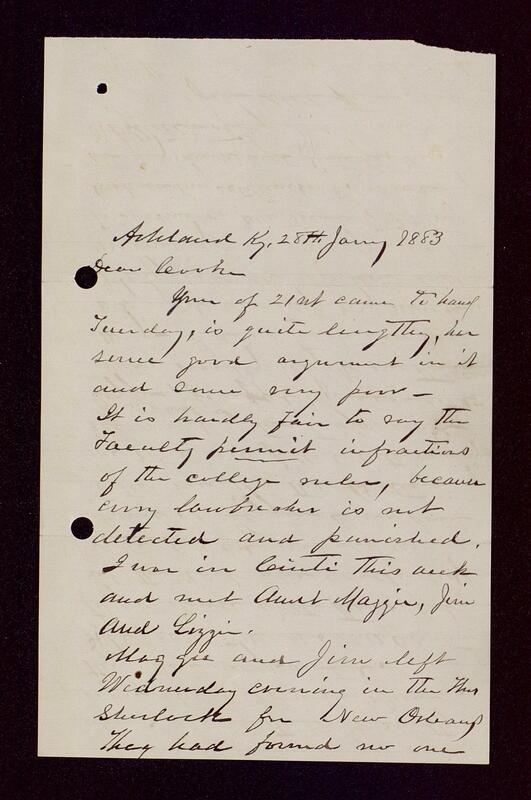 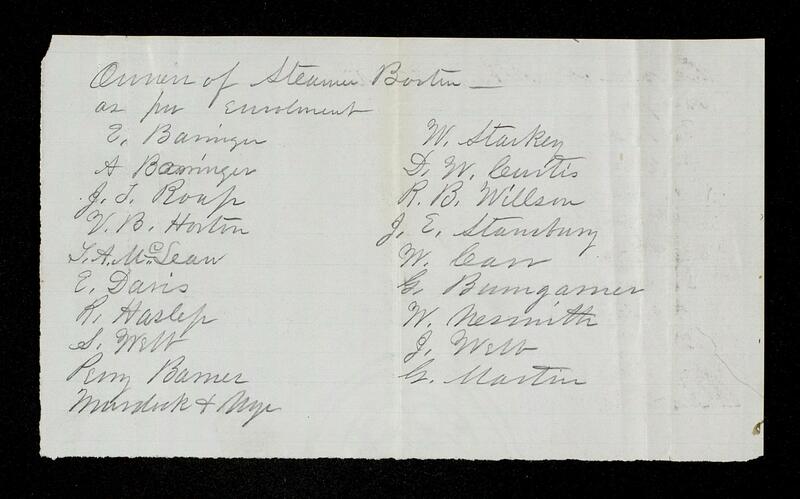 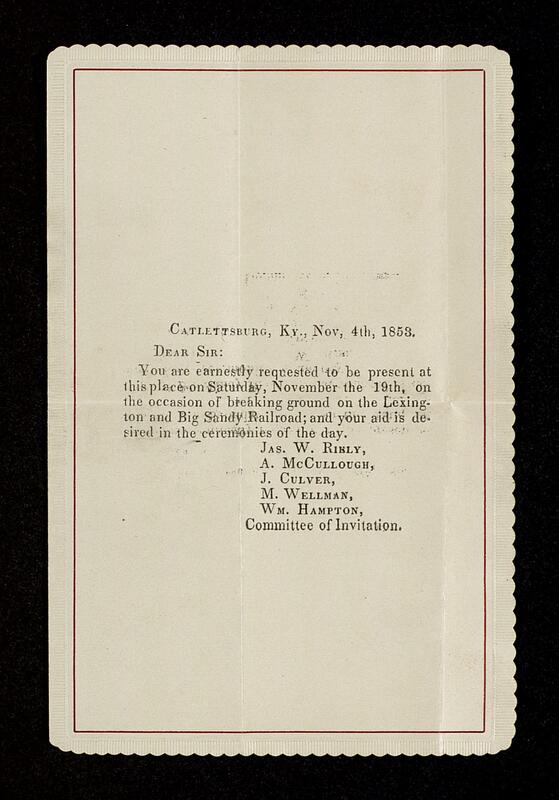 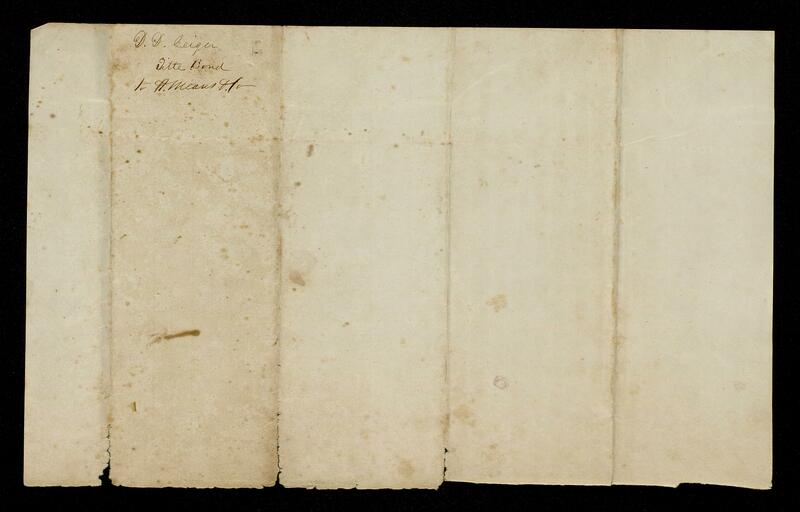 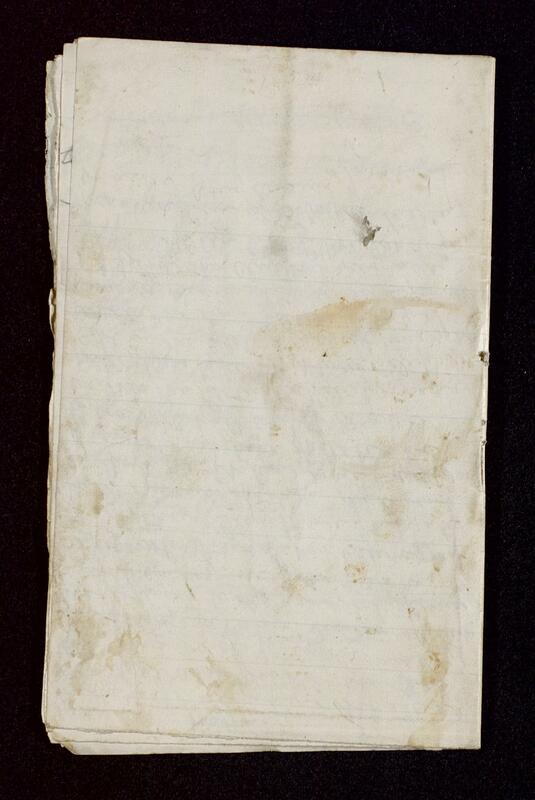 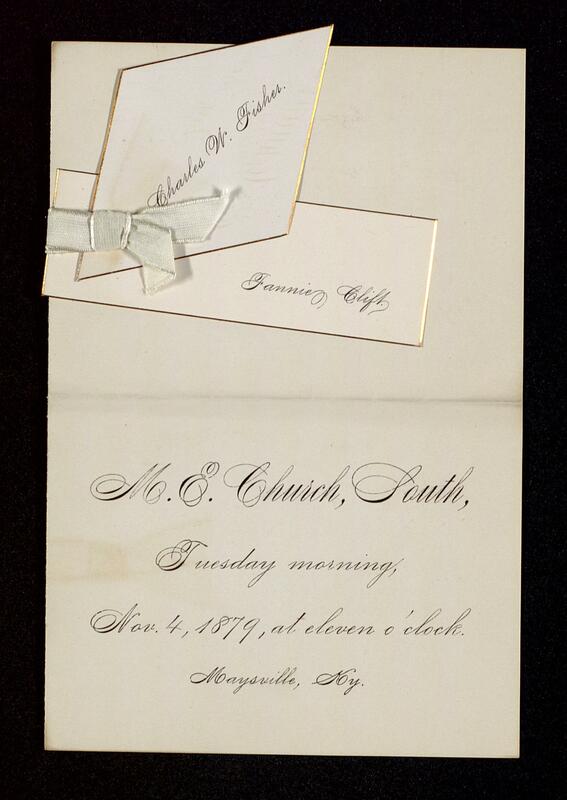 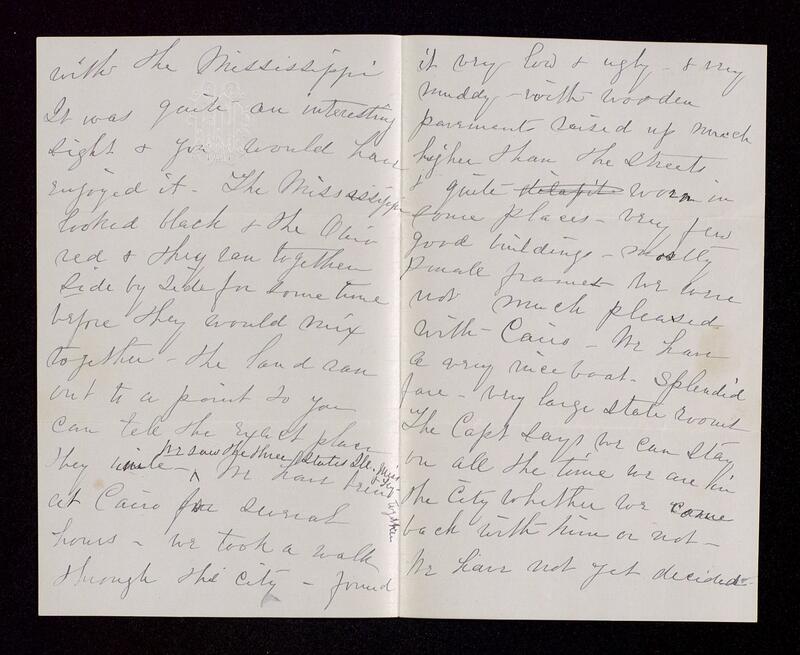 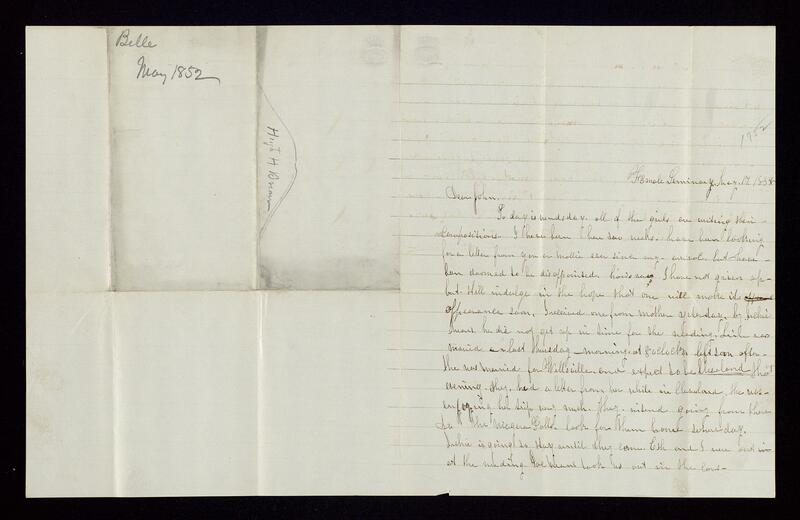 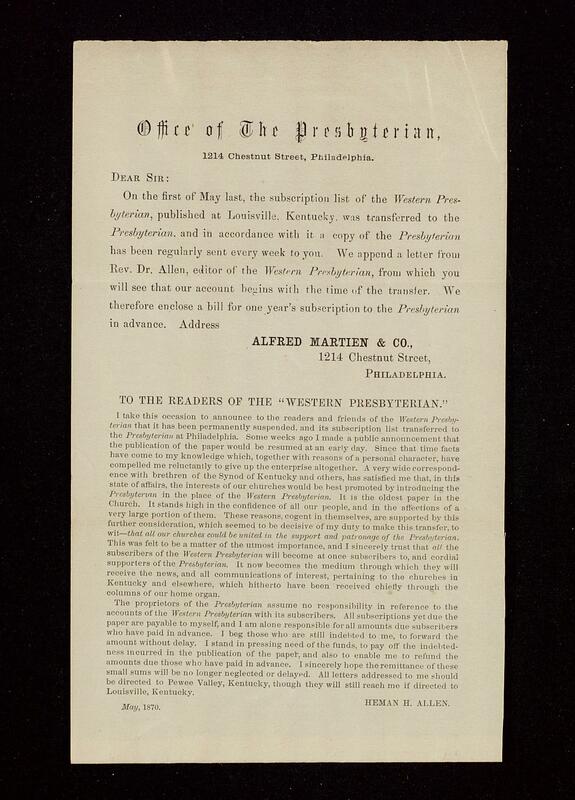 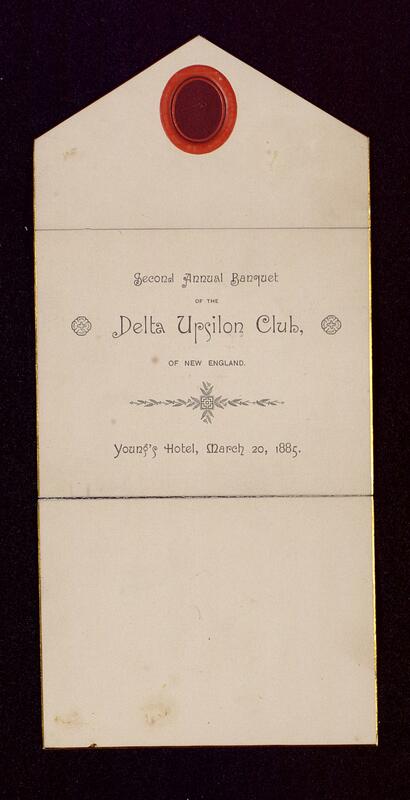 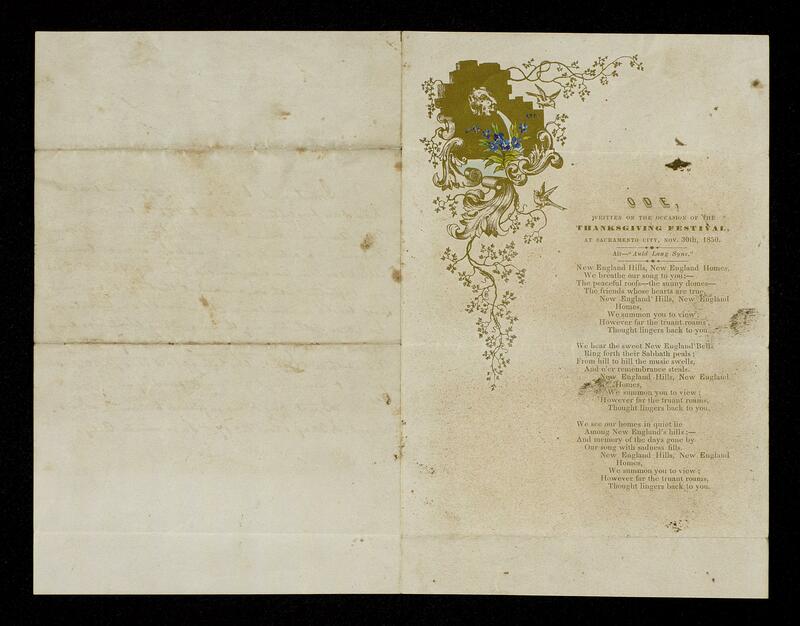 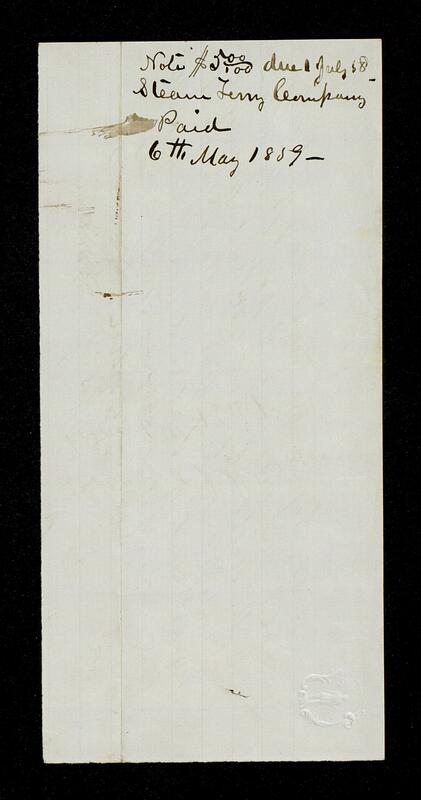 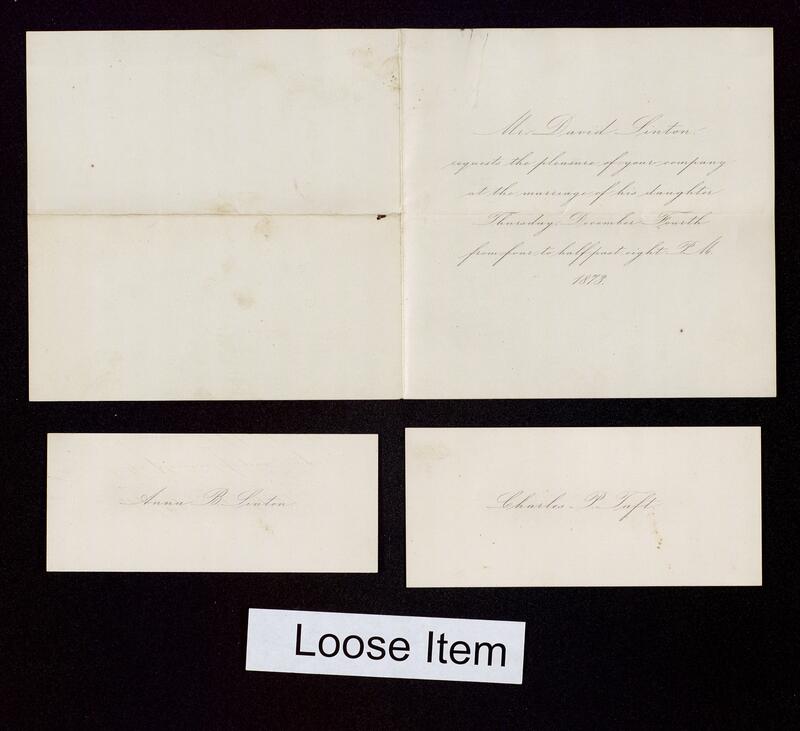 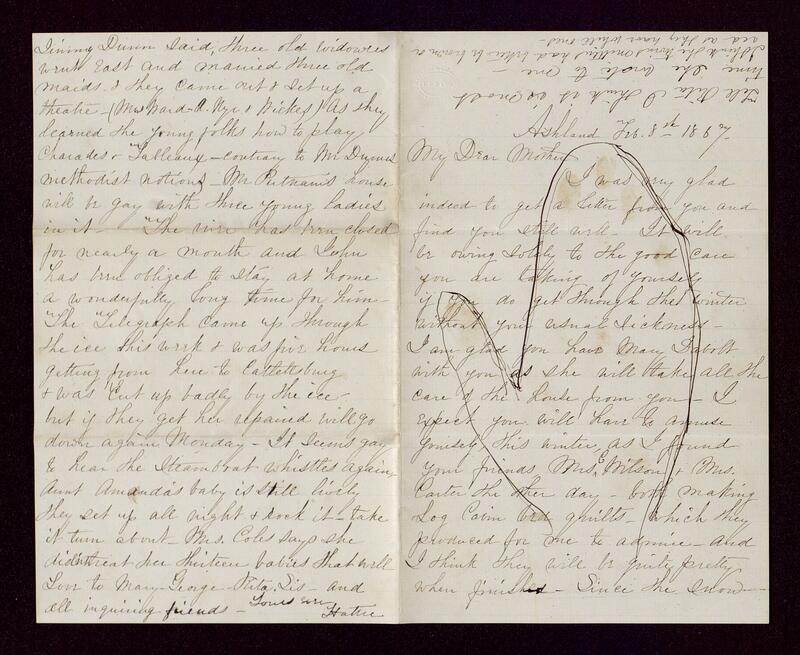 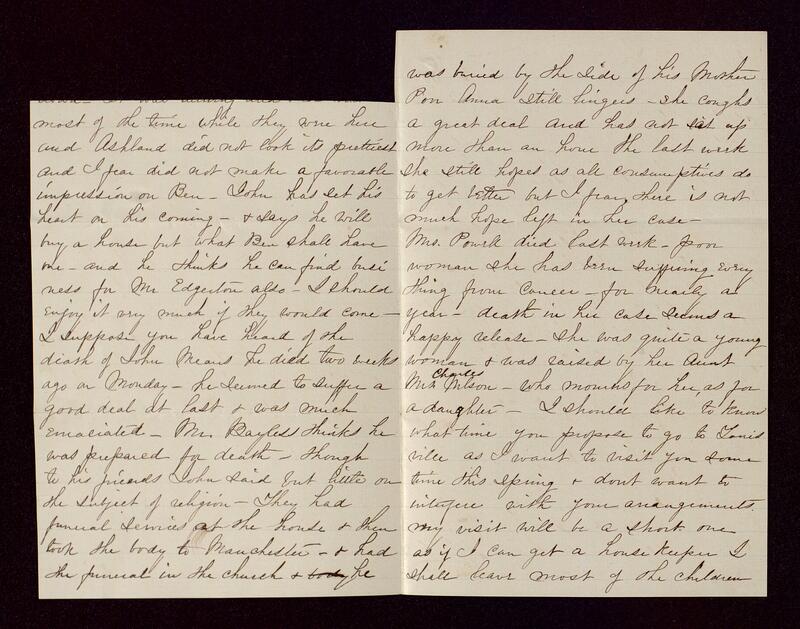 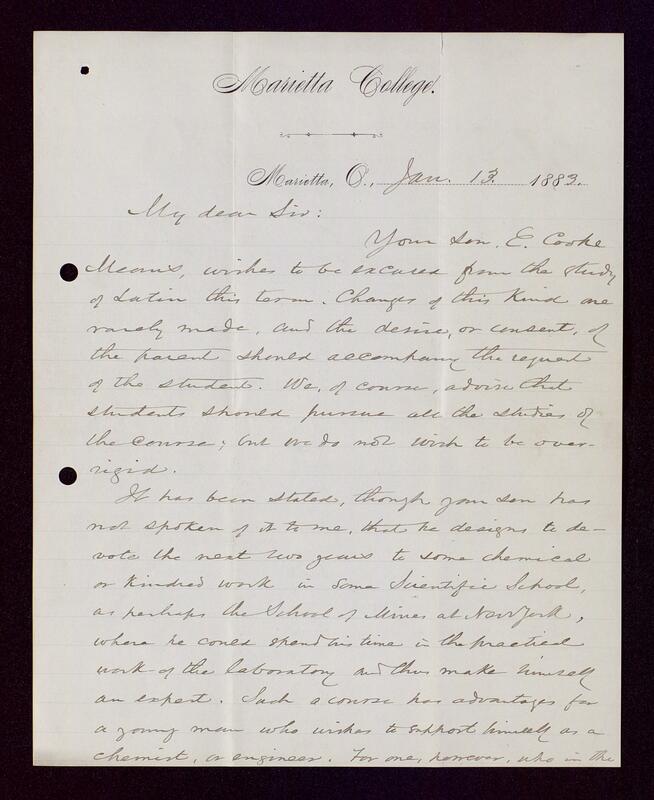 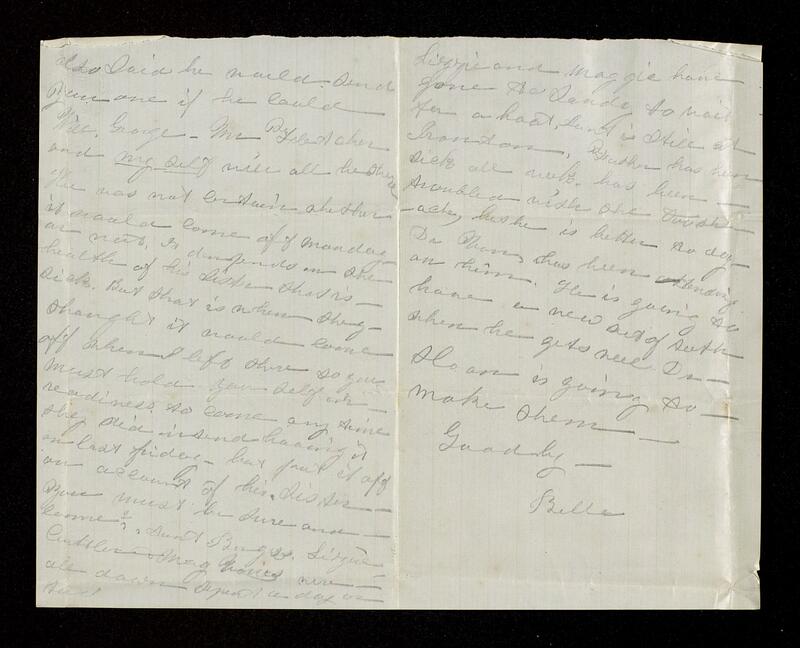 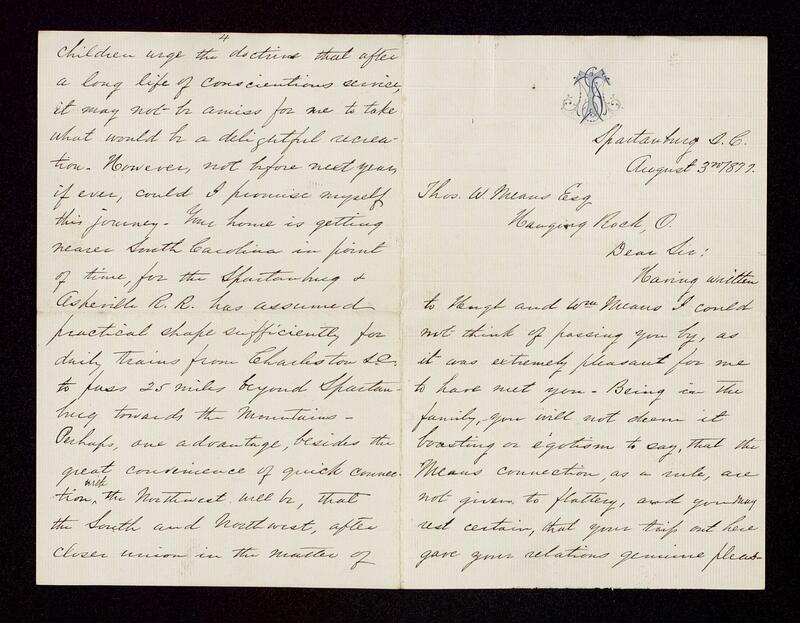 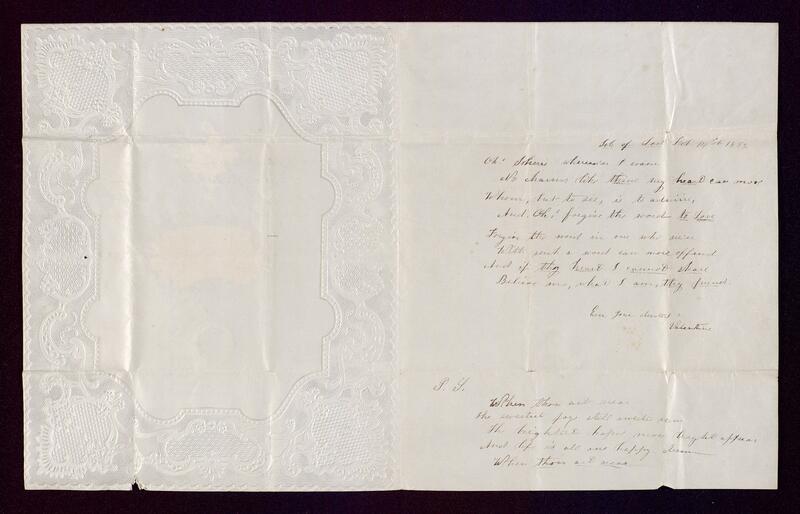 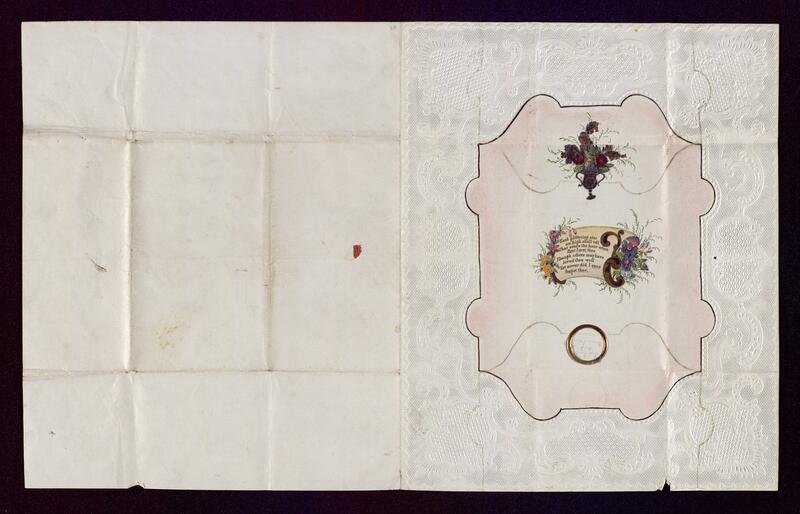 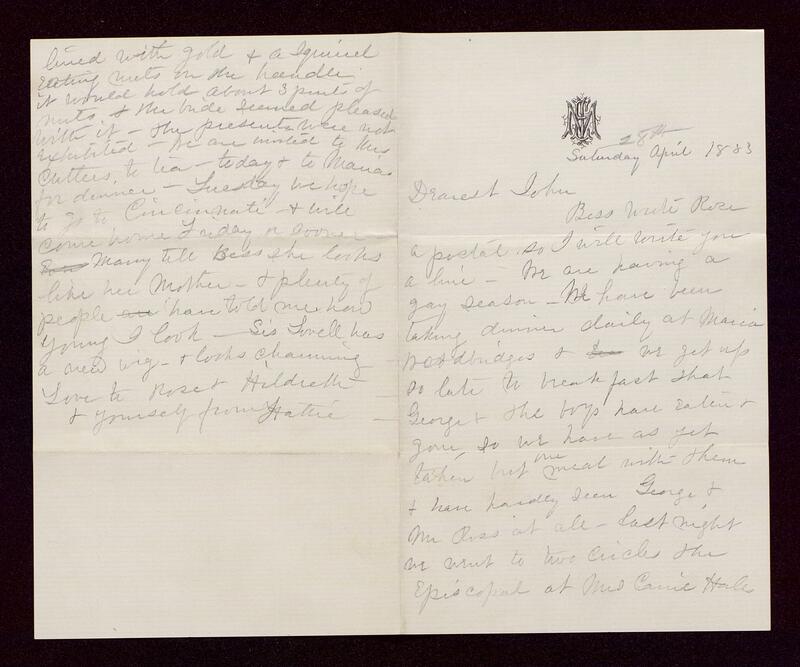 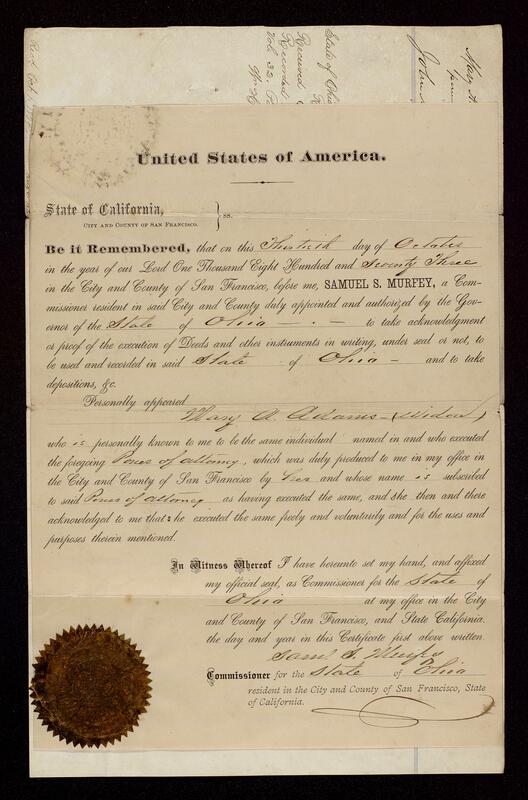 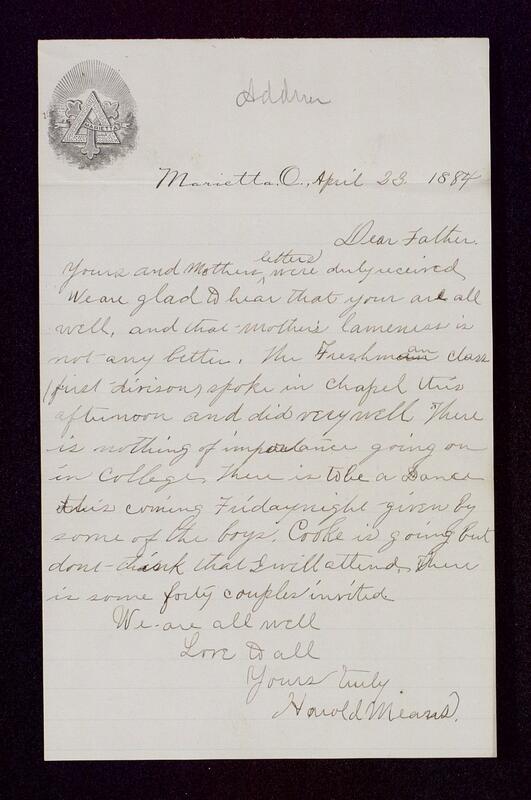 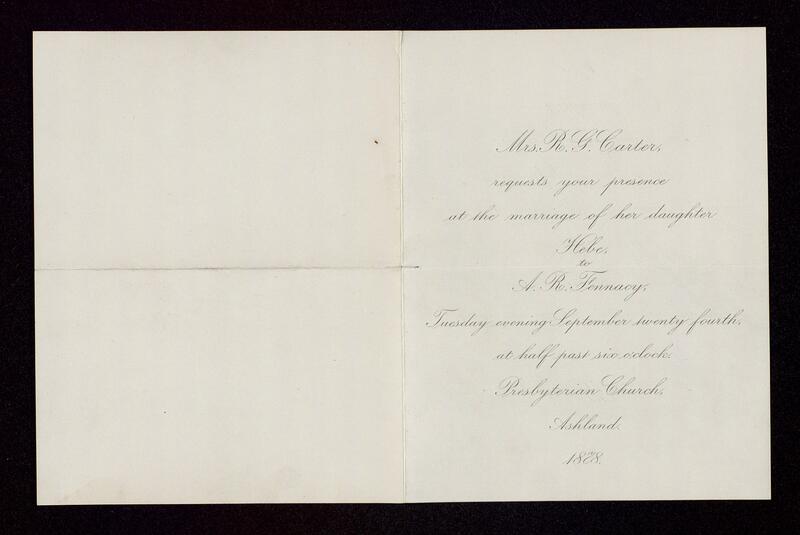 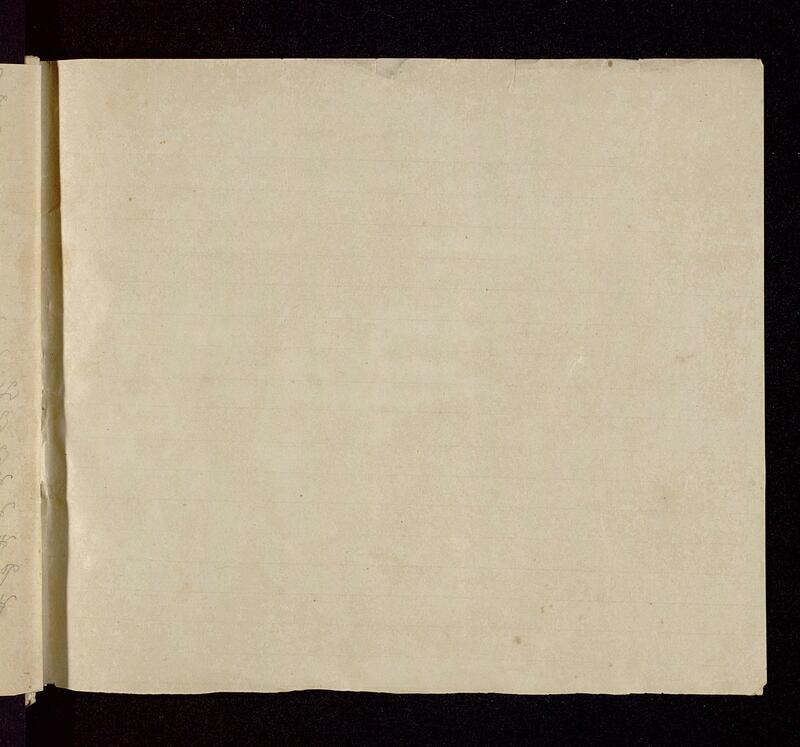 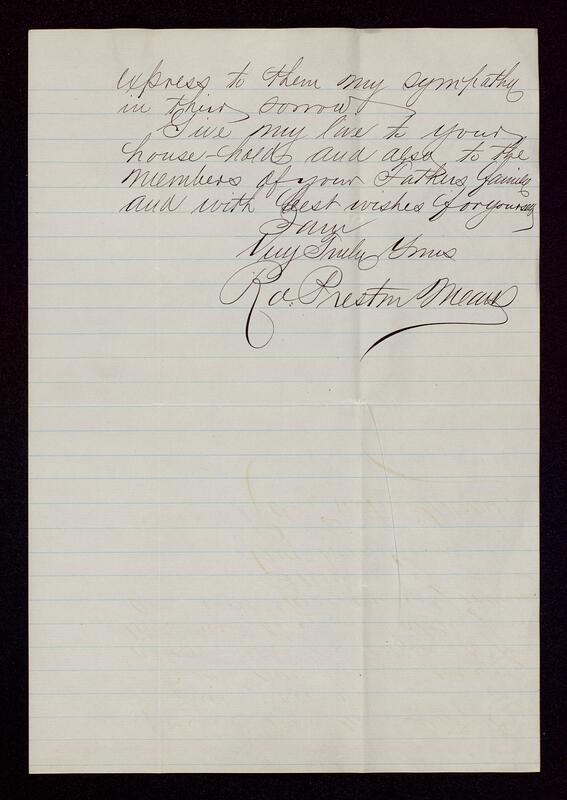 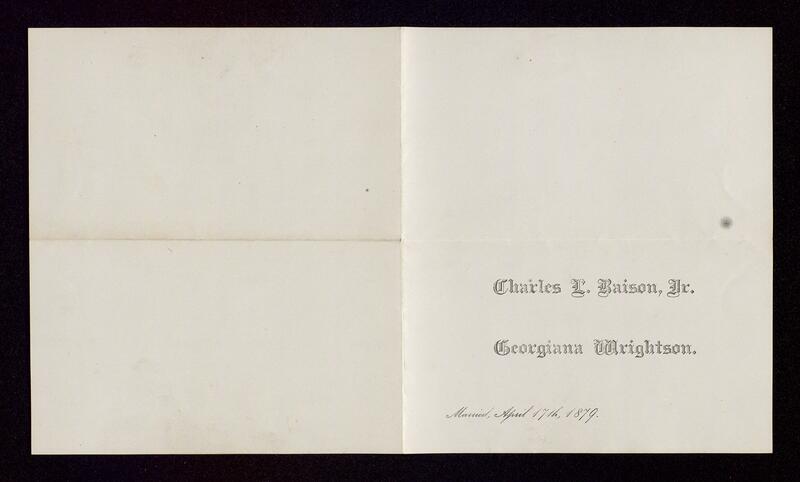 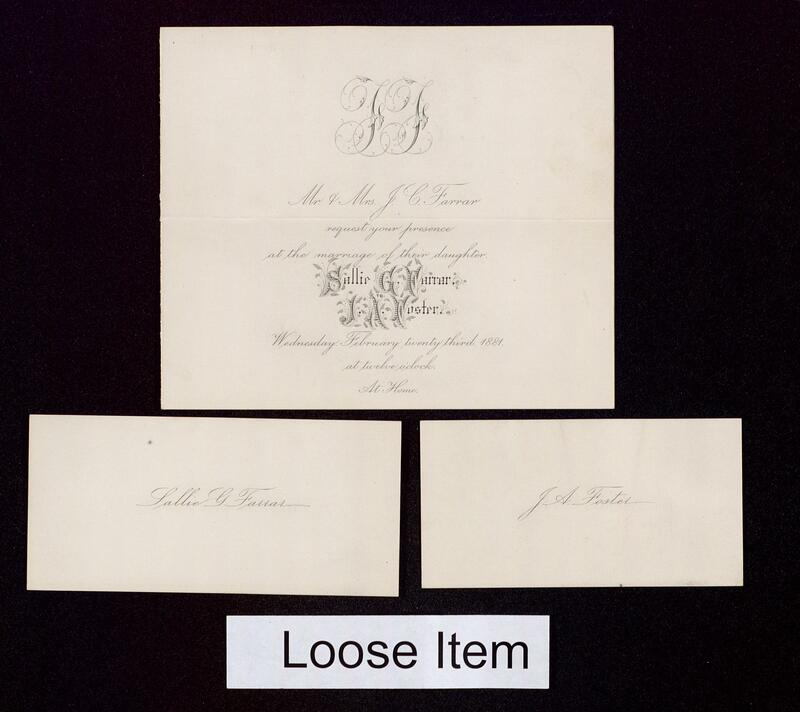 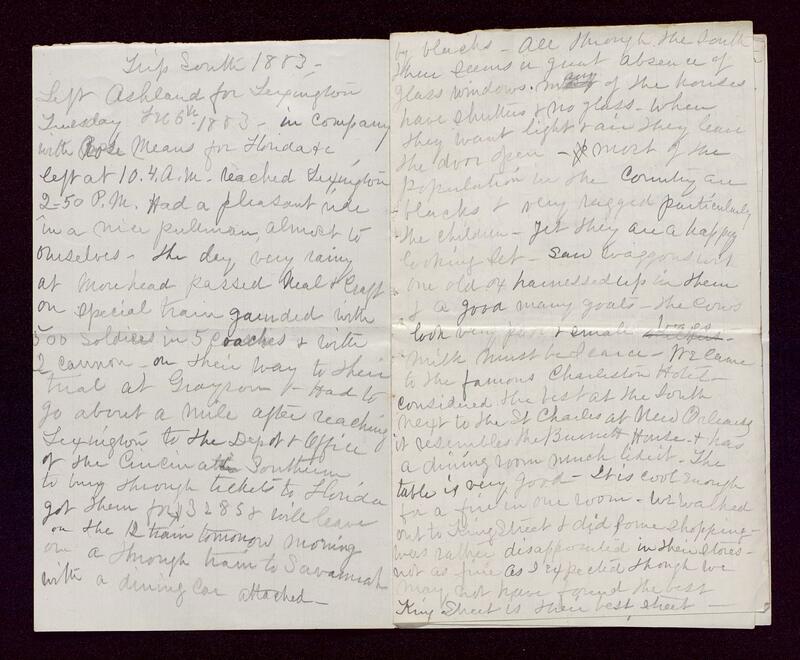 Included in these letters is a description of his participation in the funeral of President Garfield, a former member of the Delta Upsilon Fraternity at Marietta, of which E.C. 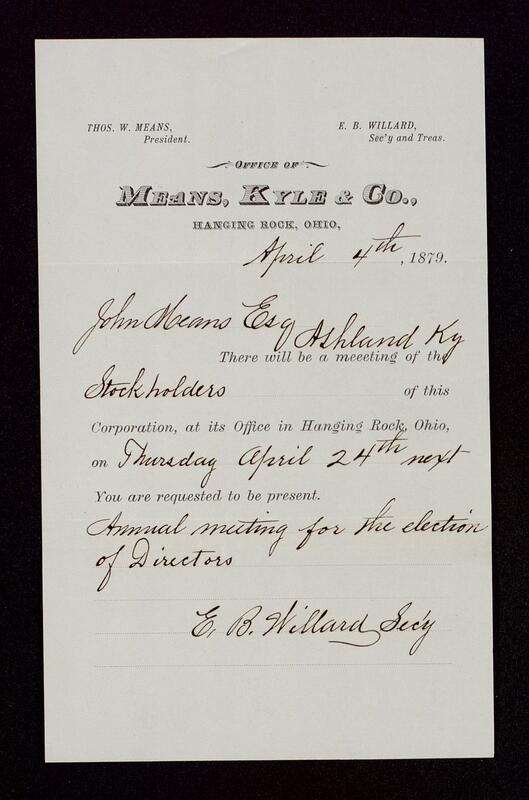 was also a member. 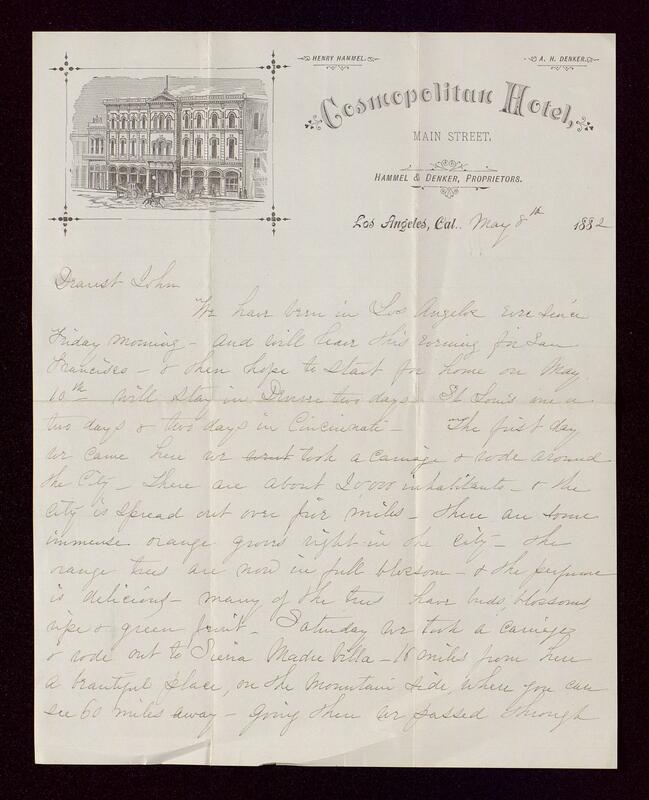 Other correspondence includes mention of the Ashland Massacre of 1881; the Marietta Flood of 1884; and description of the family's various travels throughout the United States and Europe. 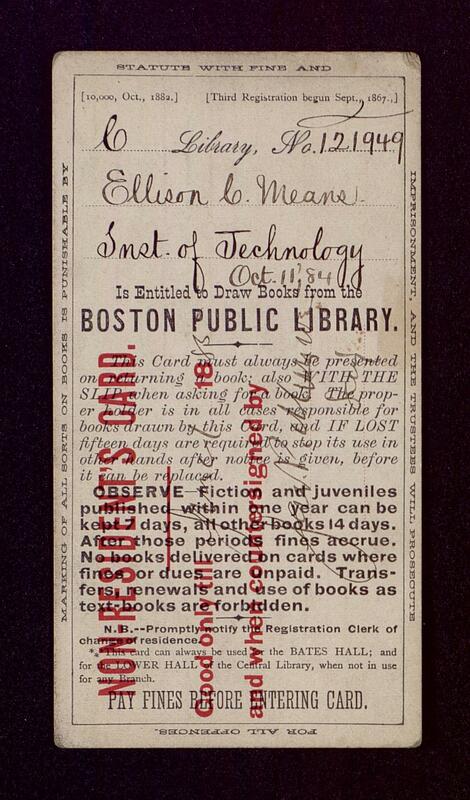 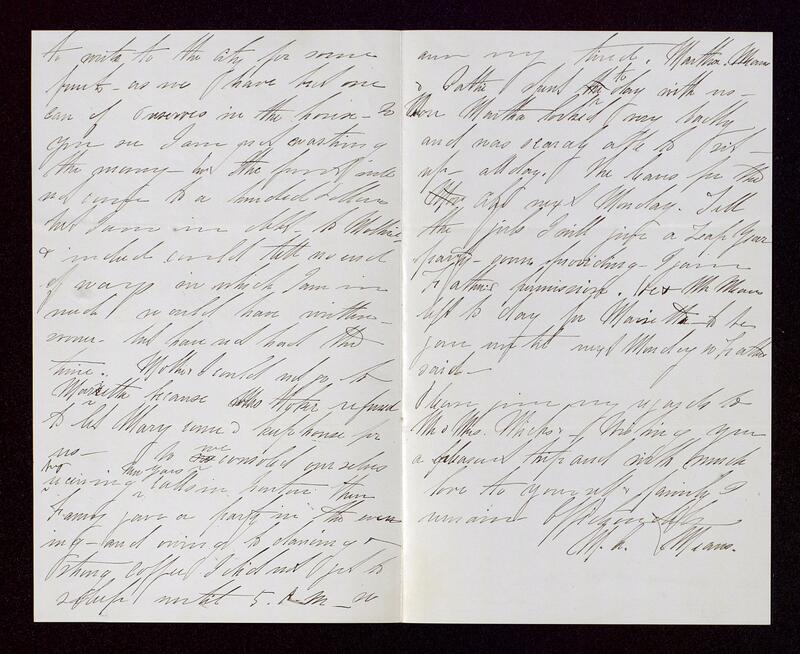 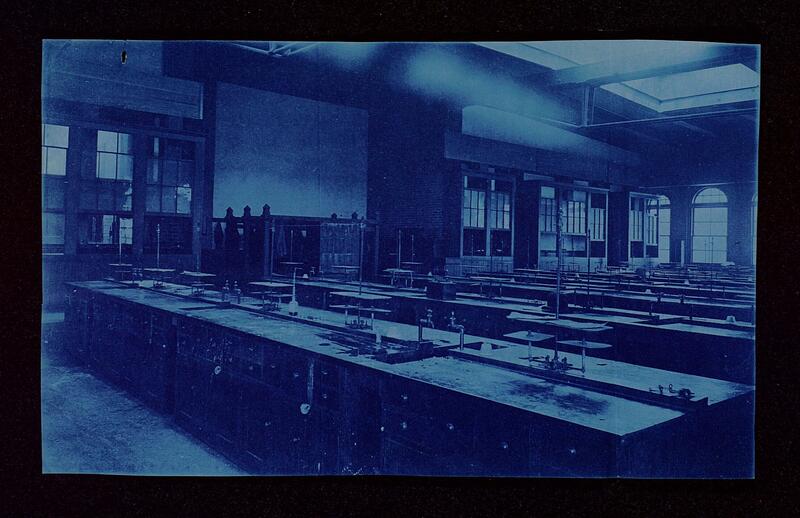 After 1887, letters from E.C. 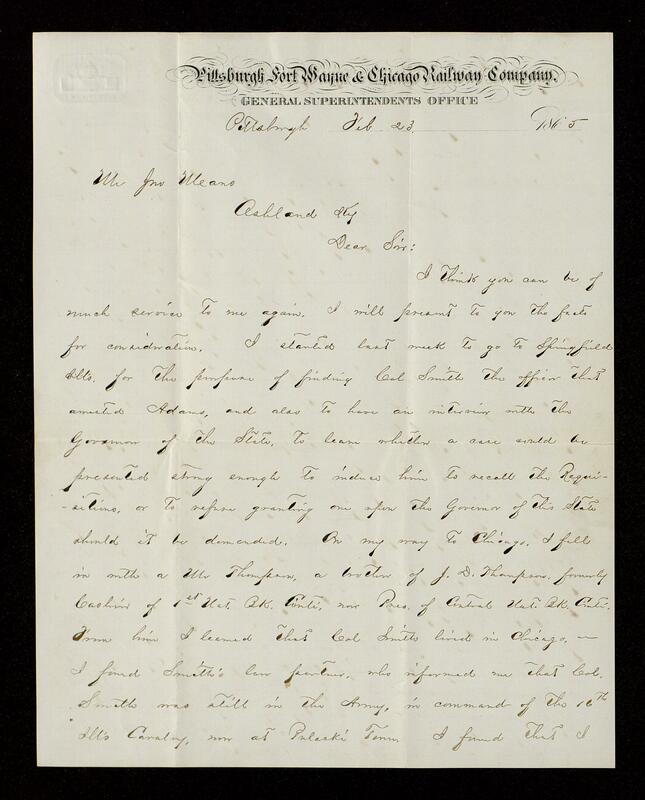 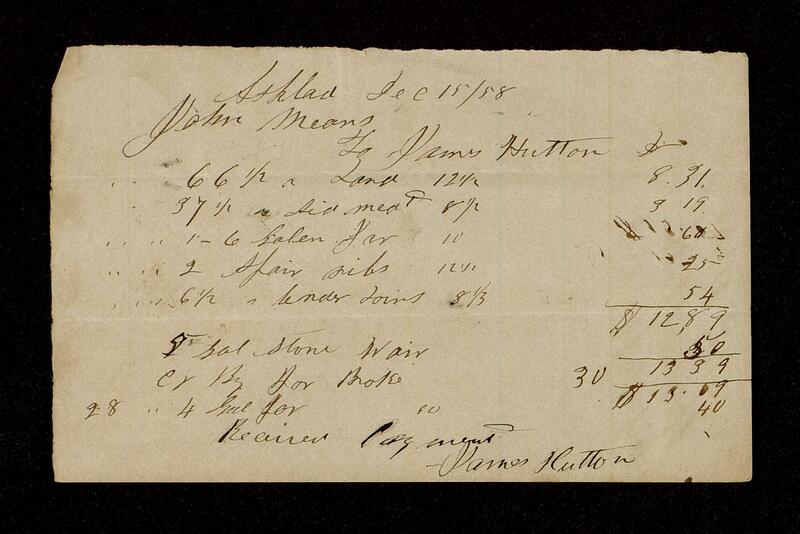 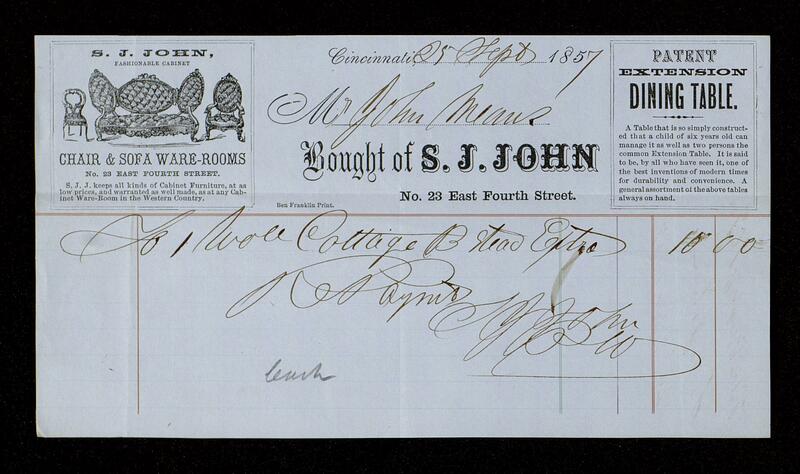 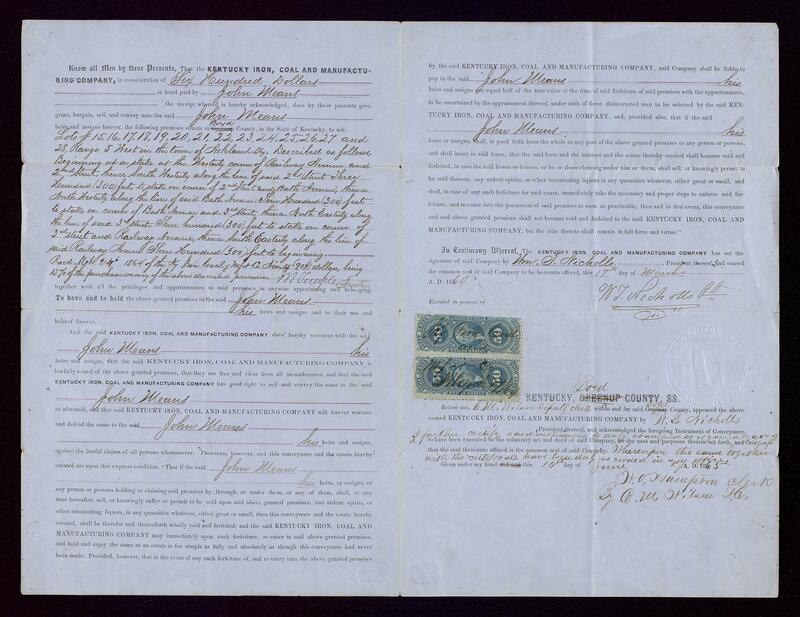 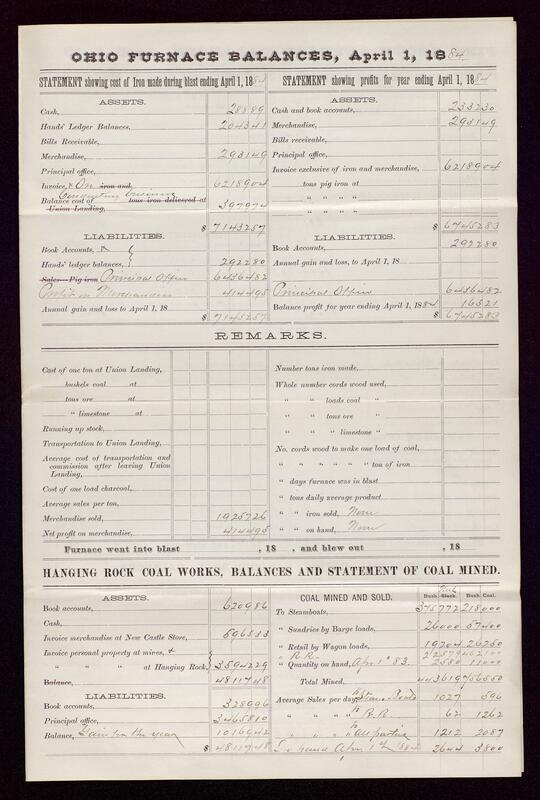 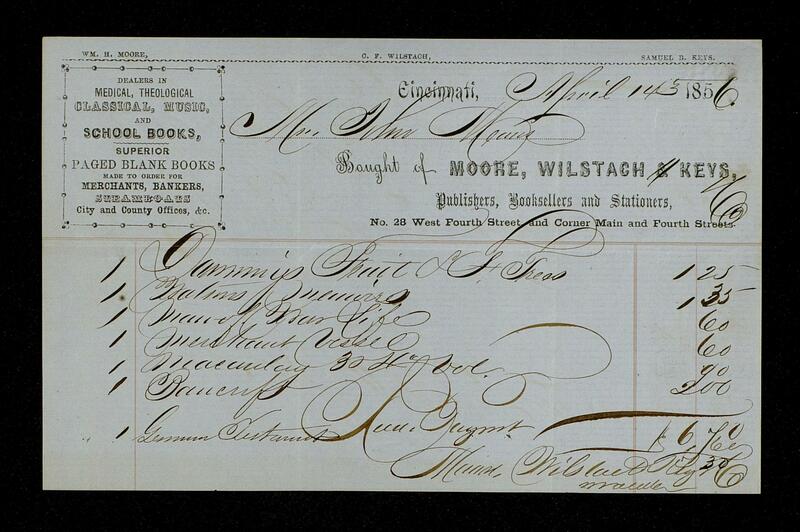 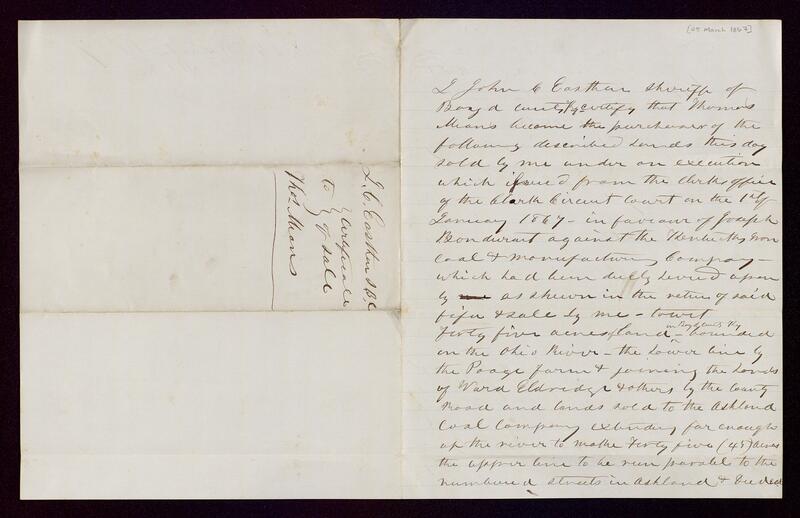 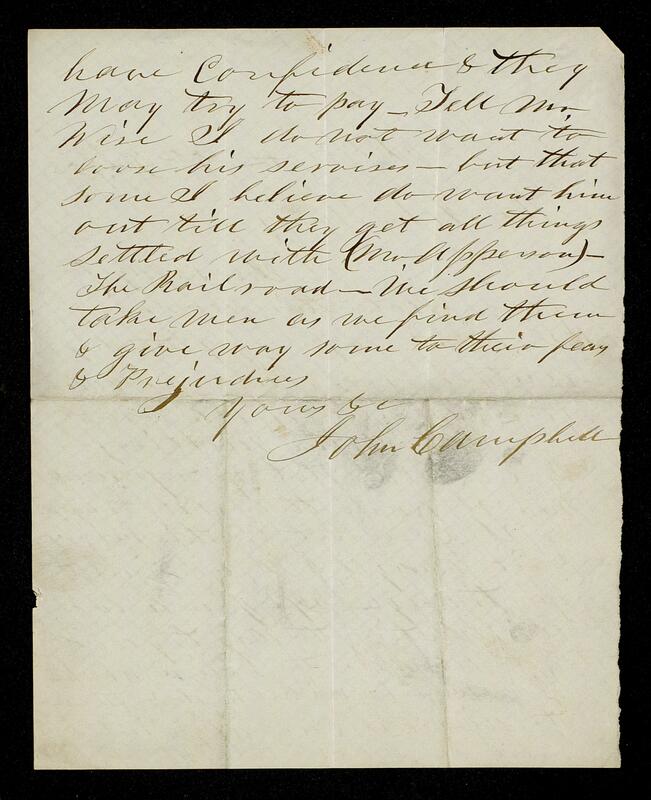 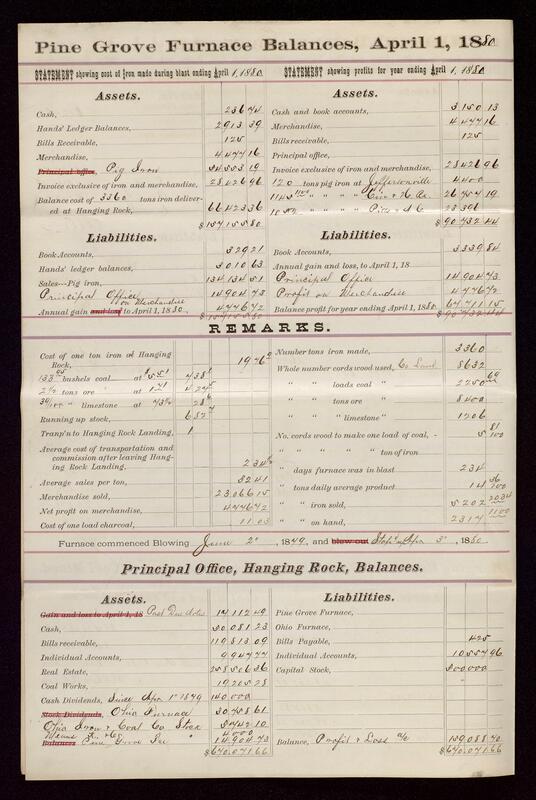 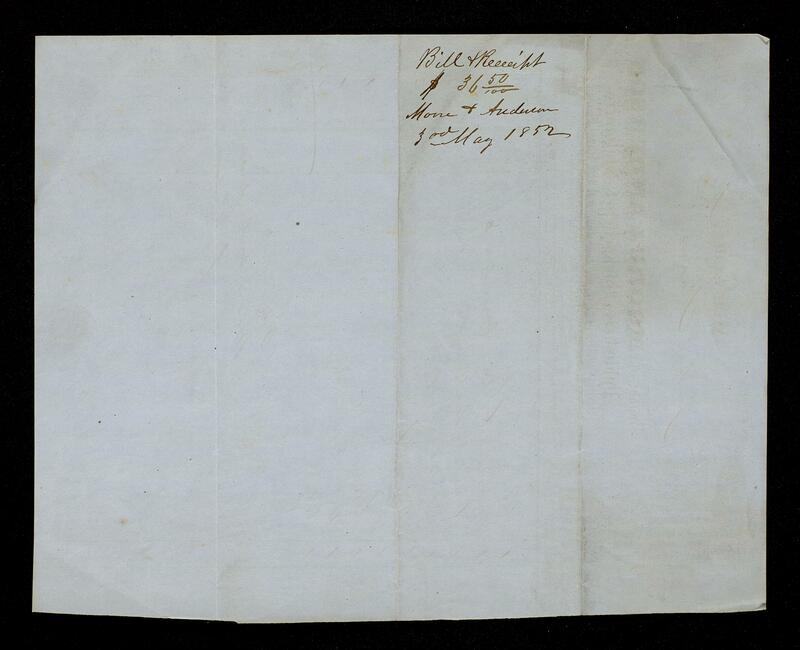 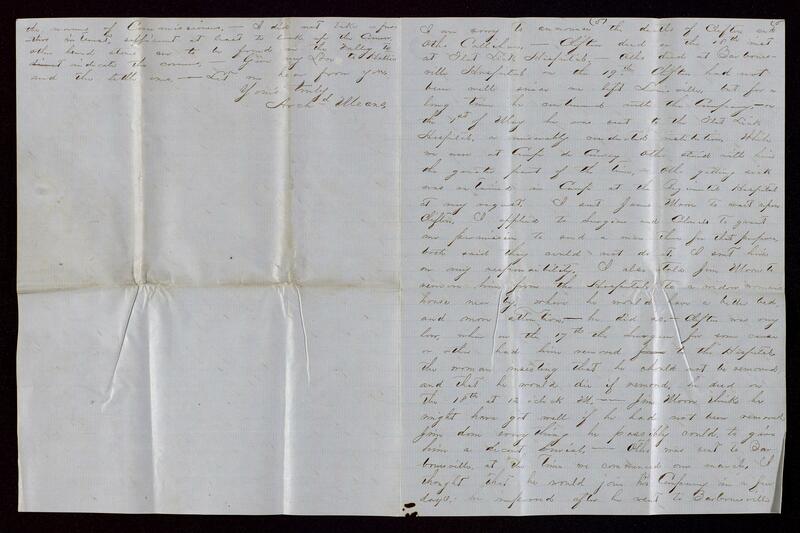 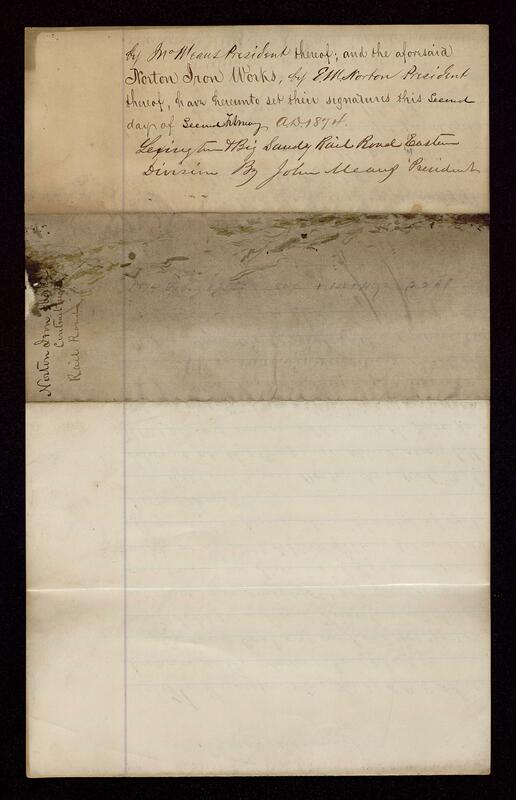 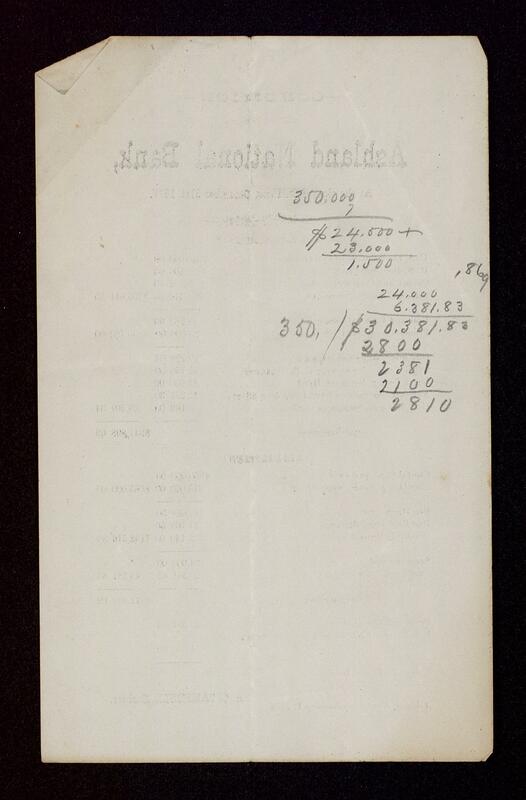 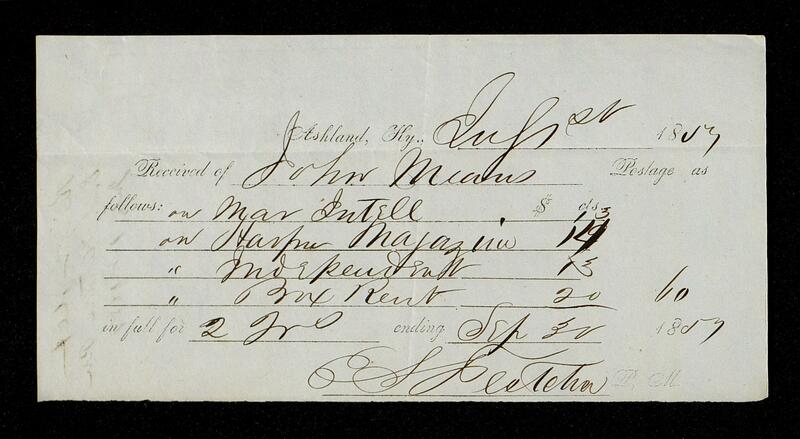 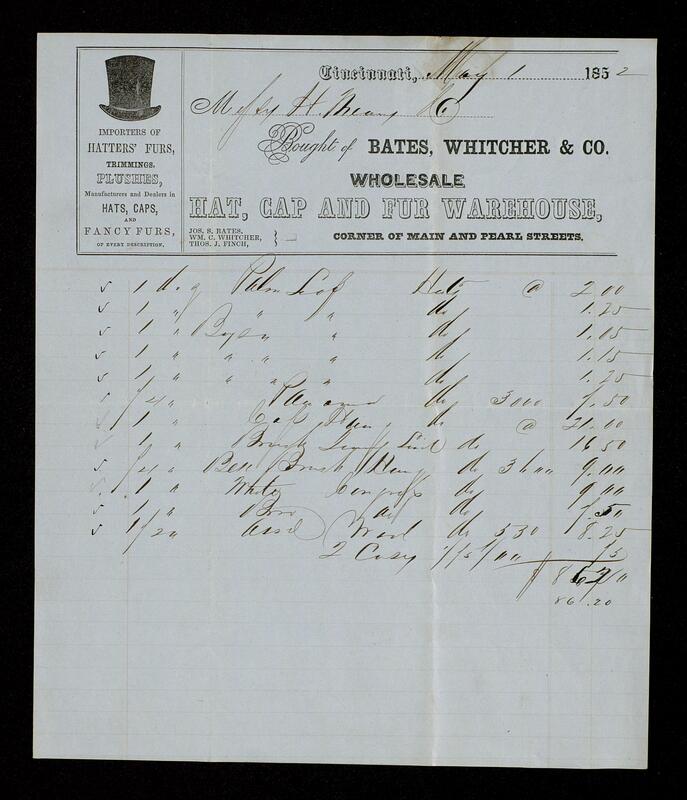 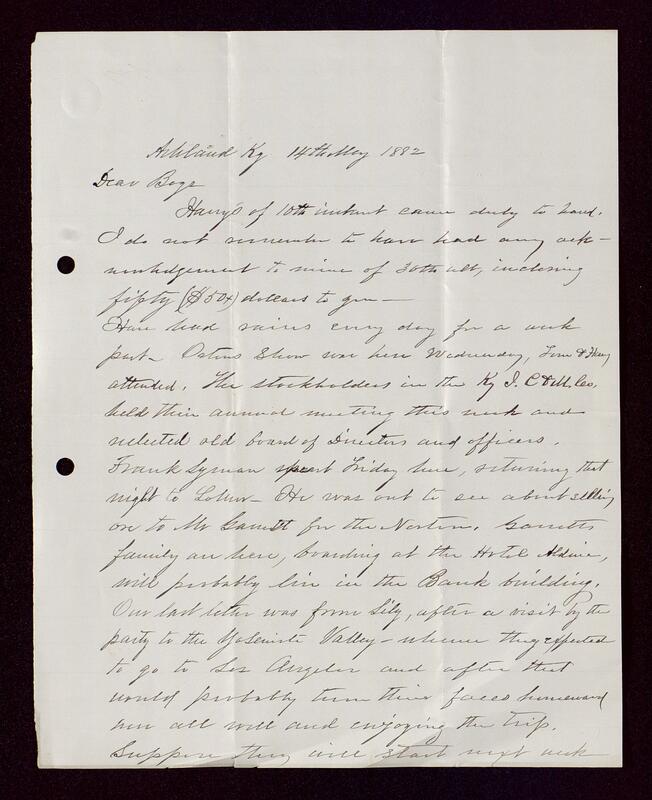 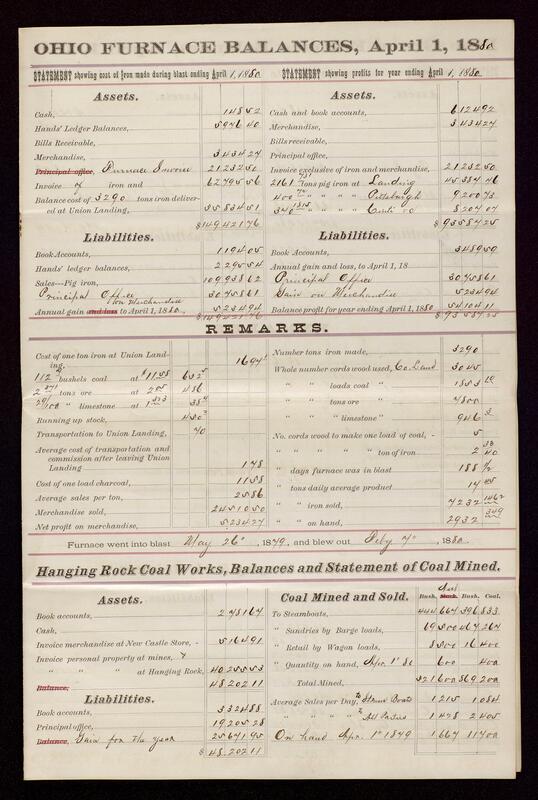 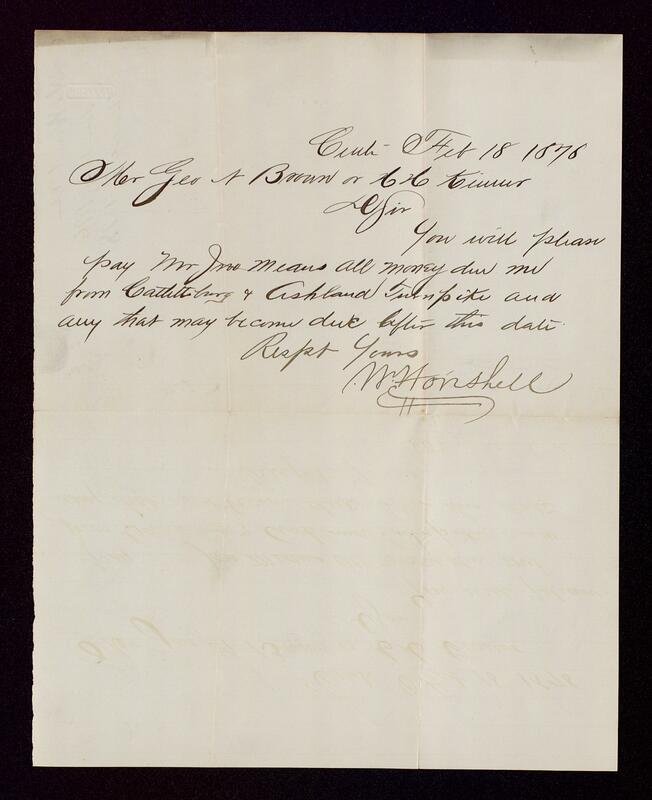 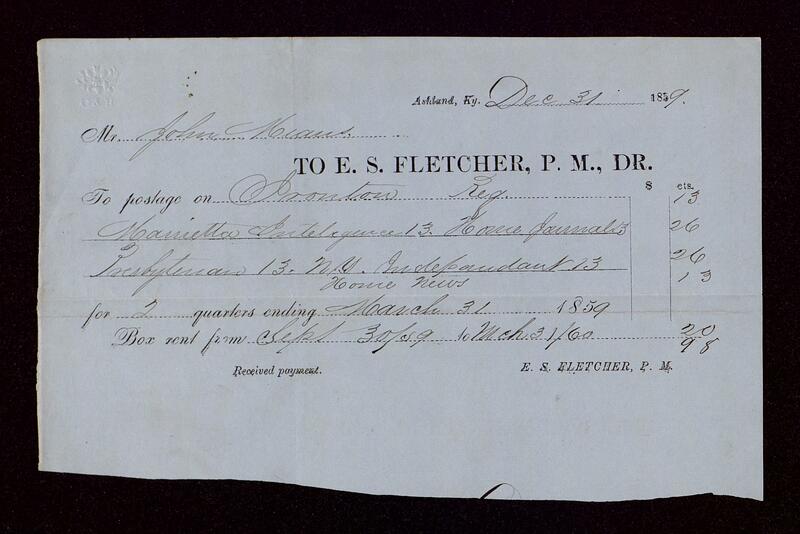 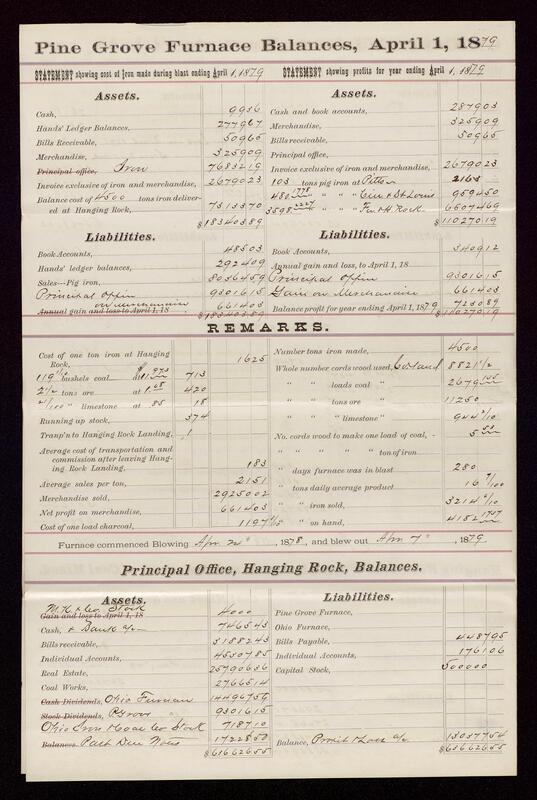 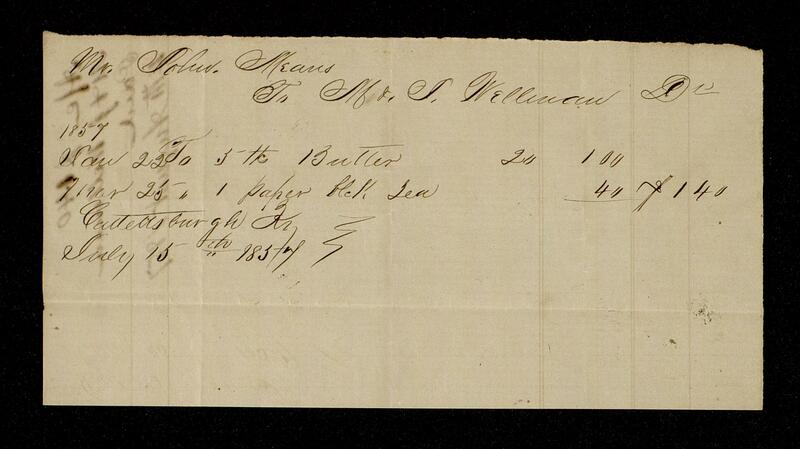 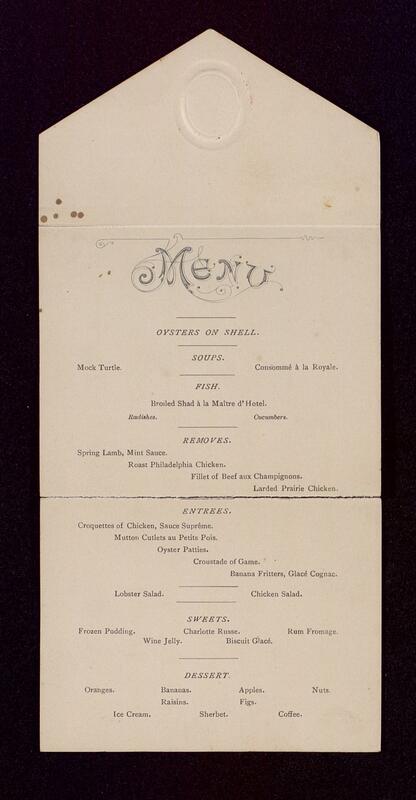 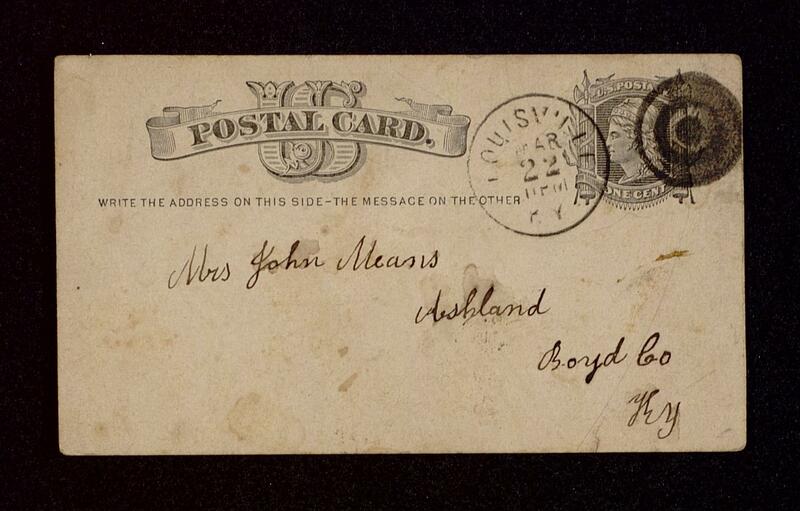 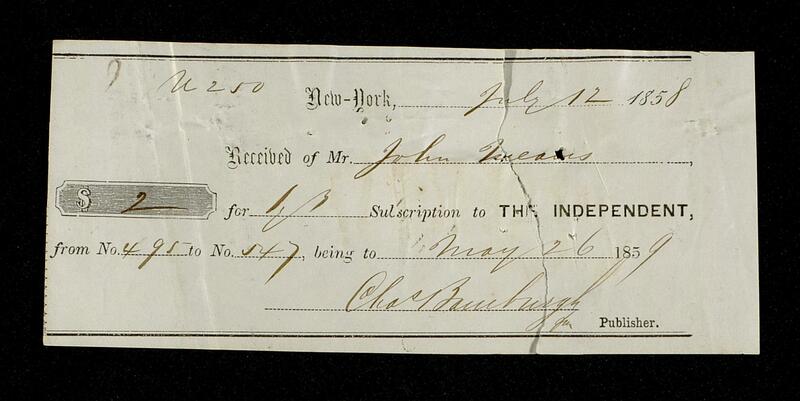 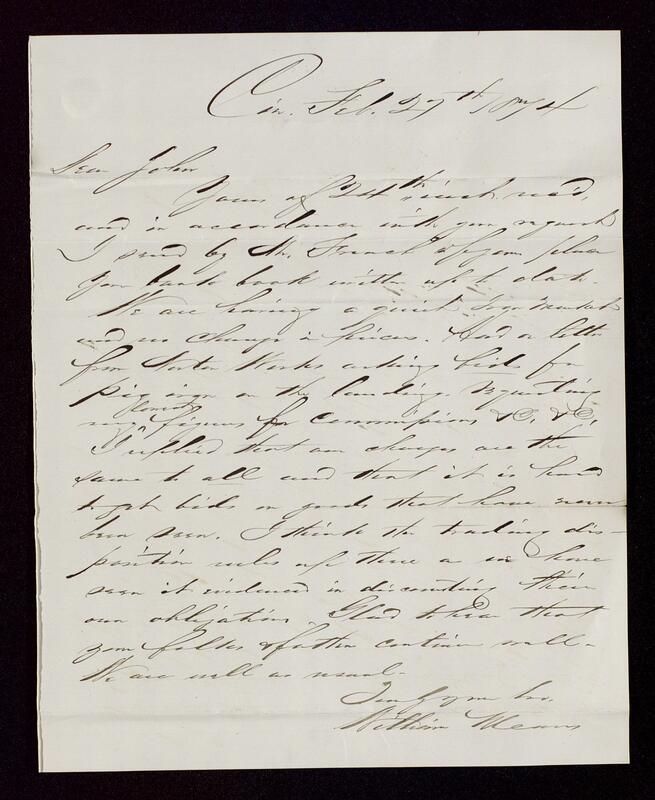 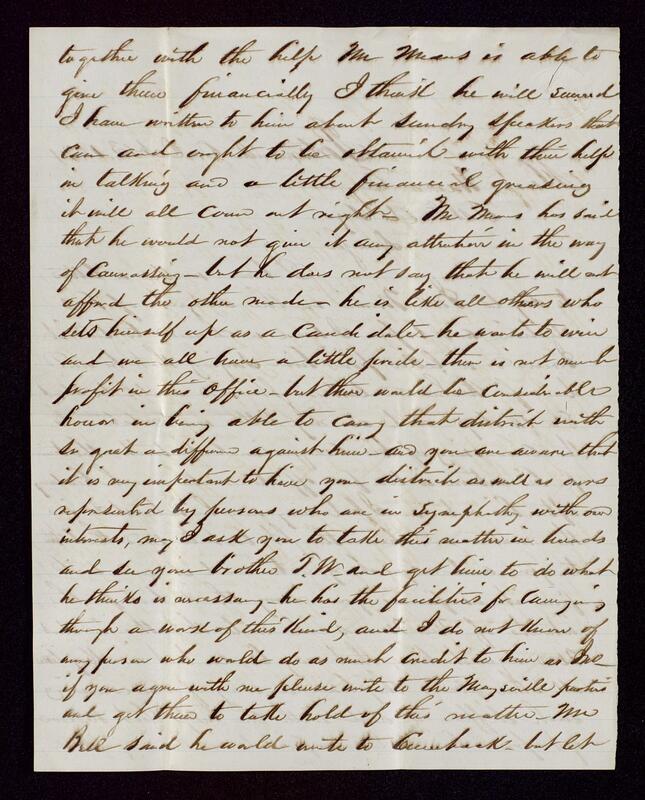 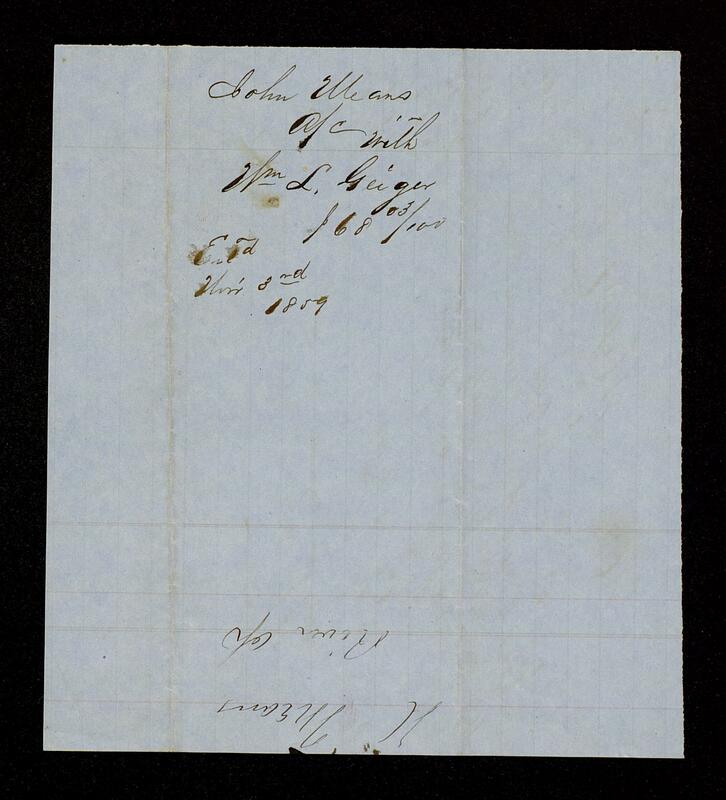 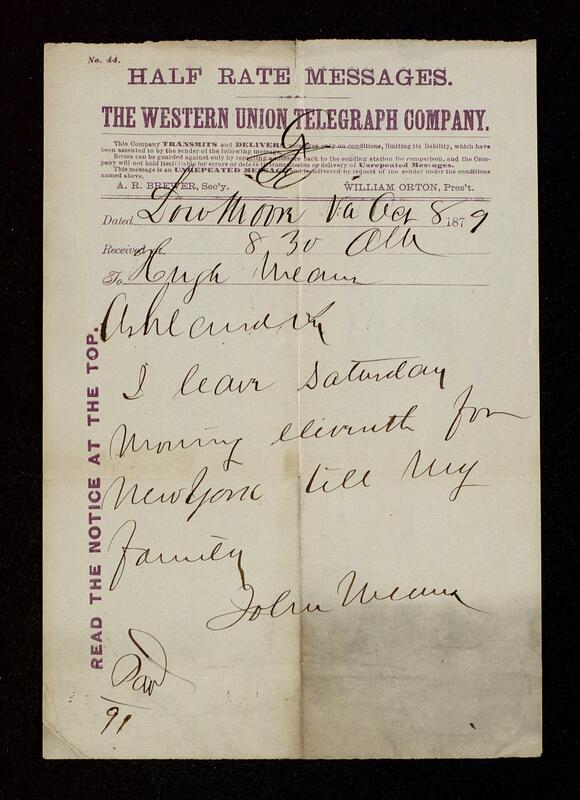 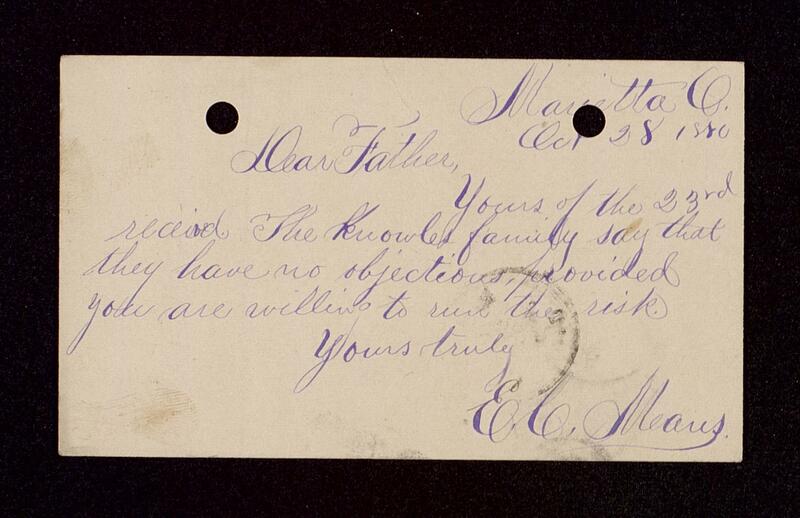 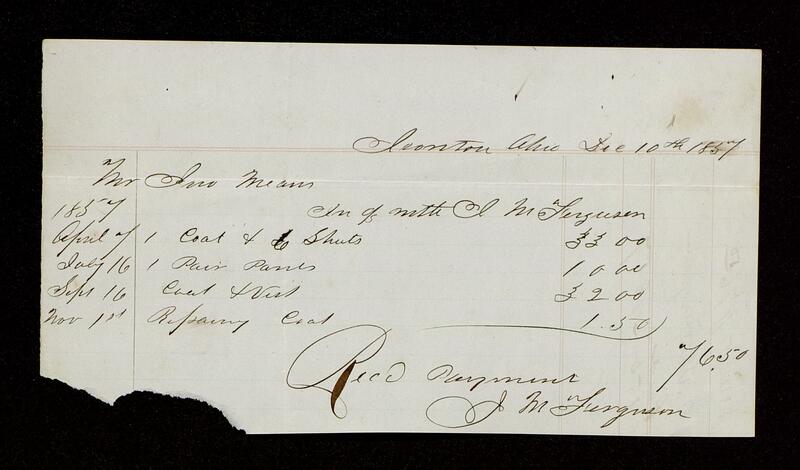 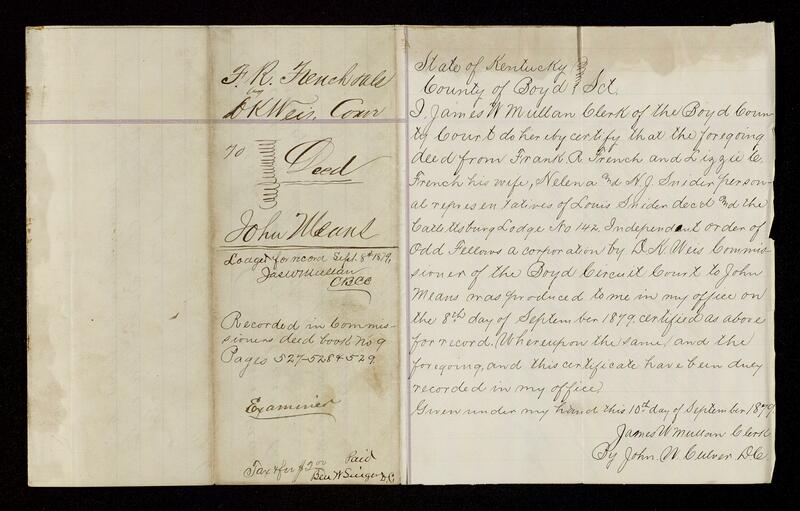 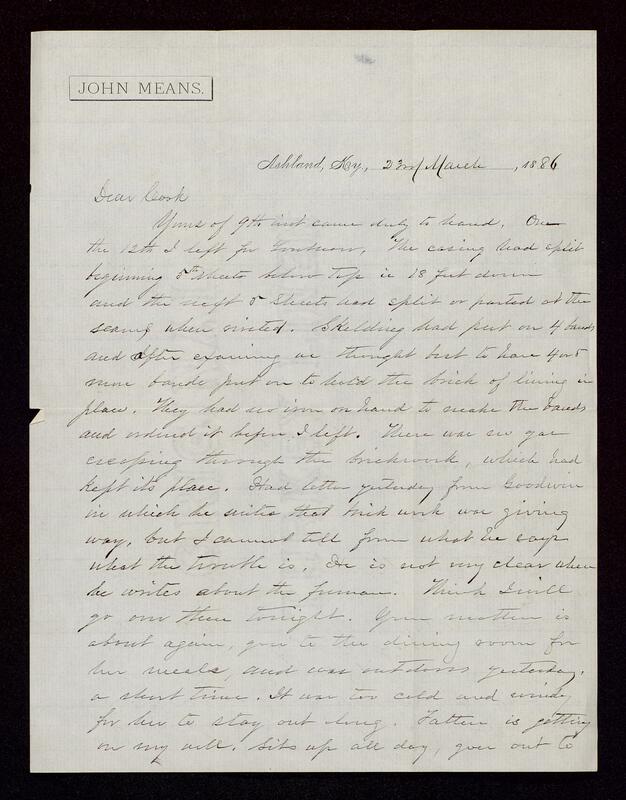 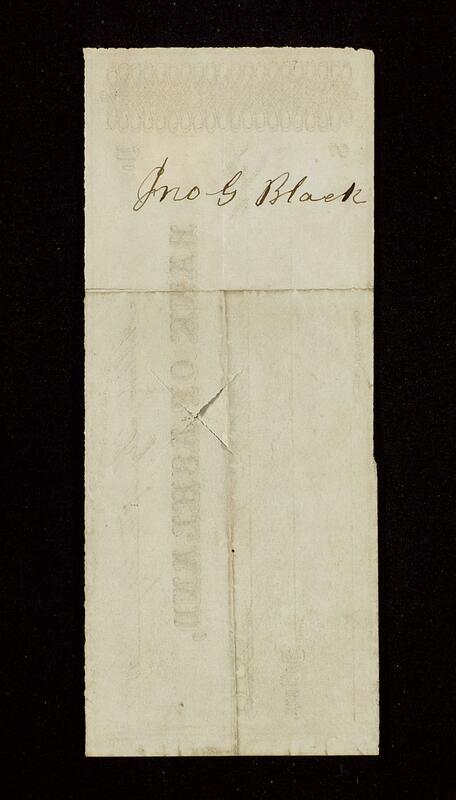 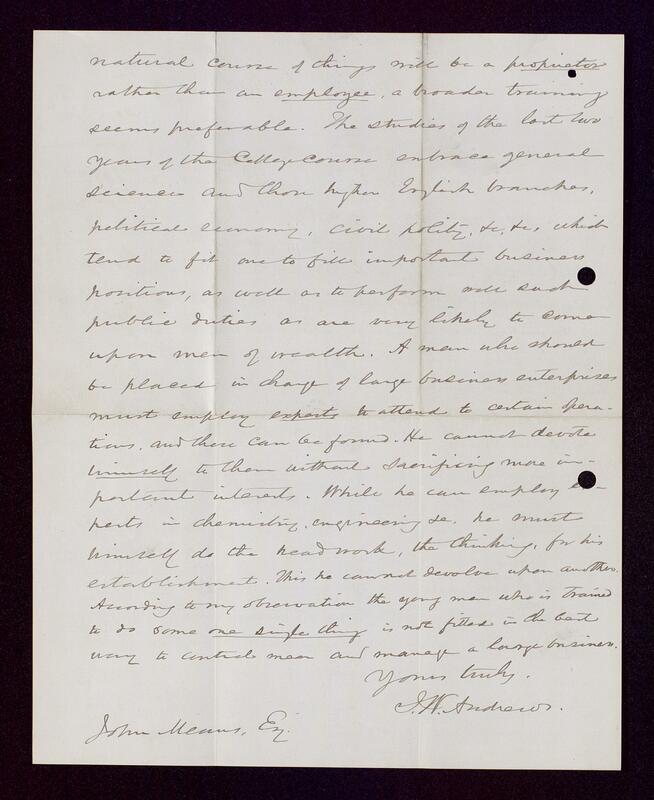 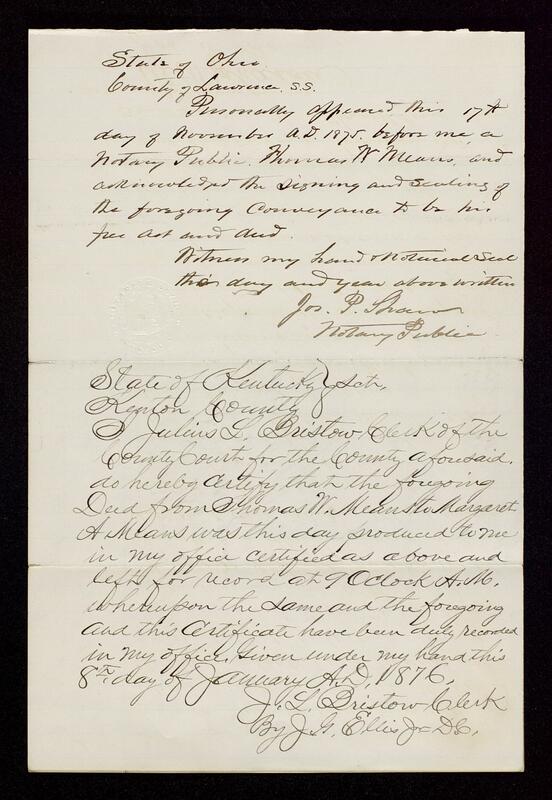 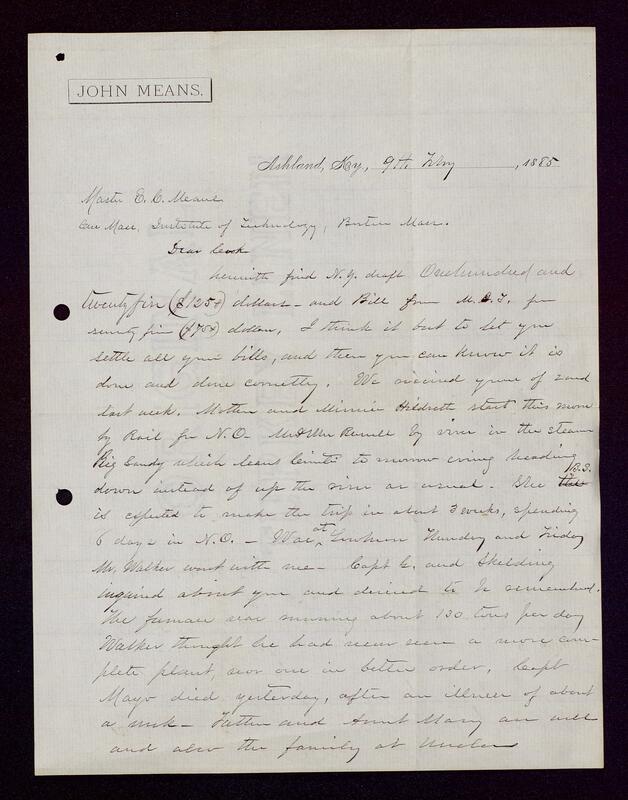 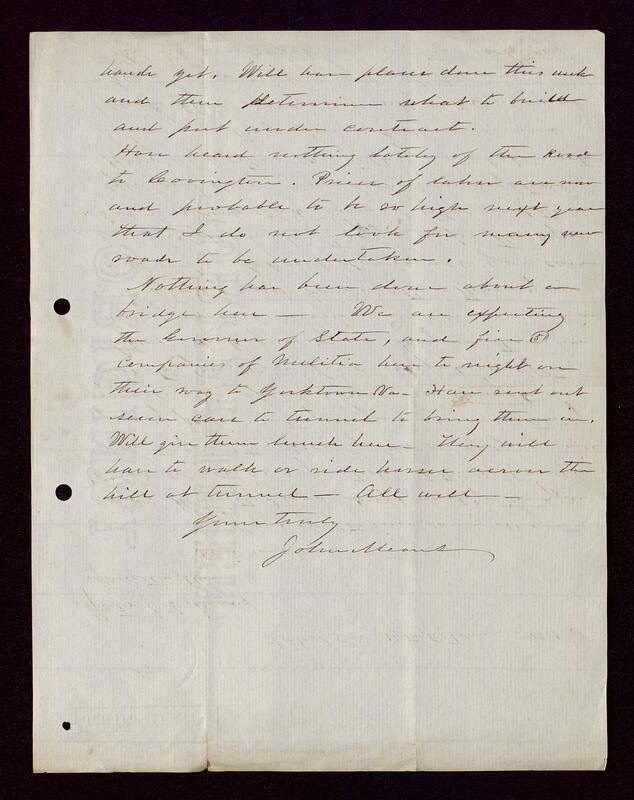 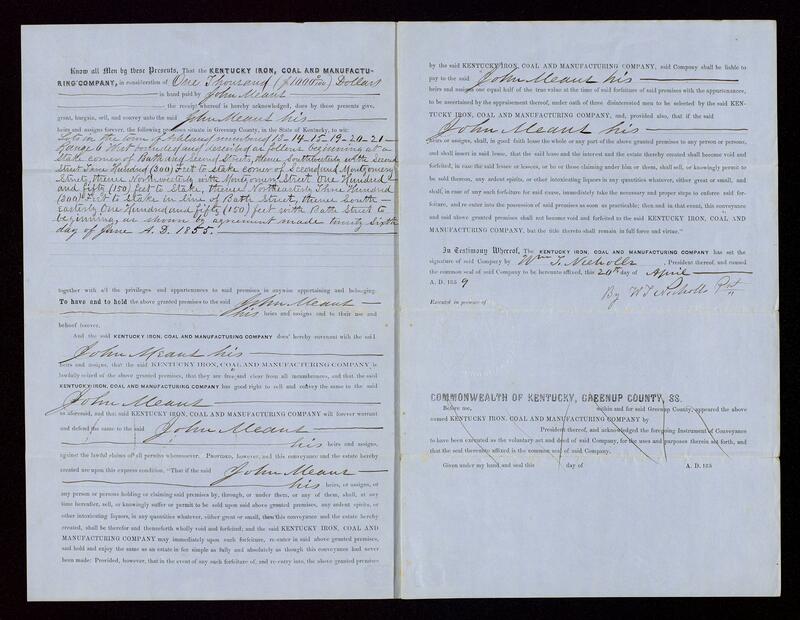 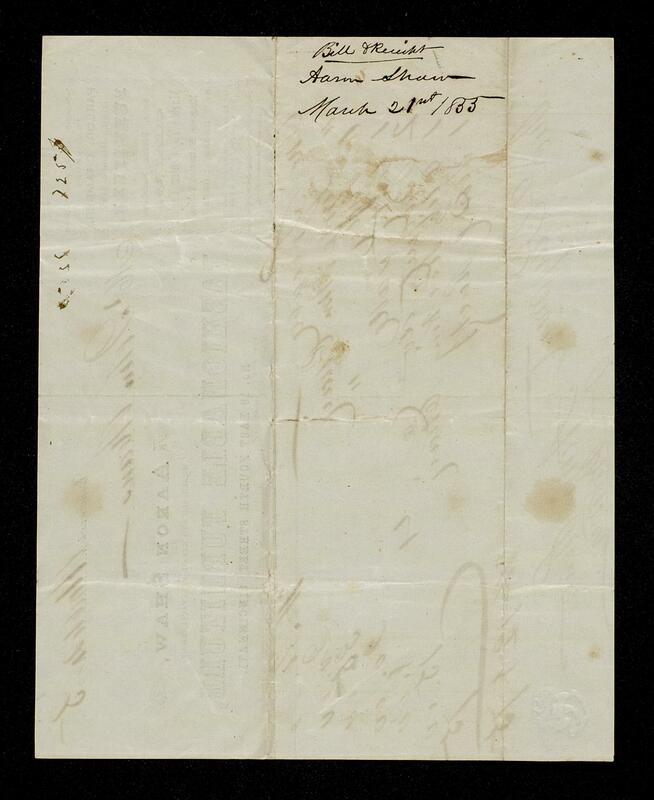 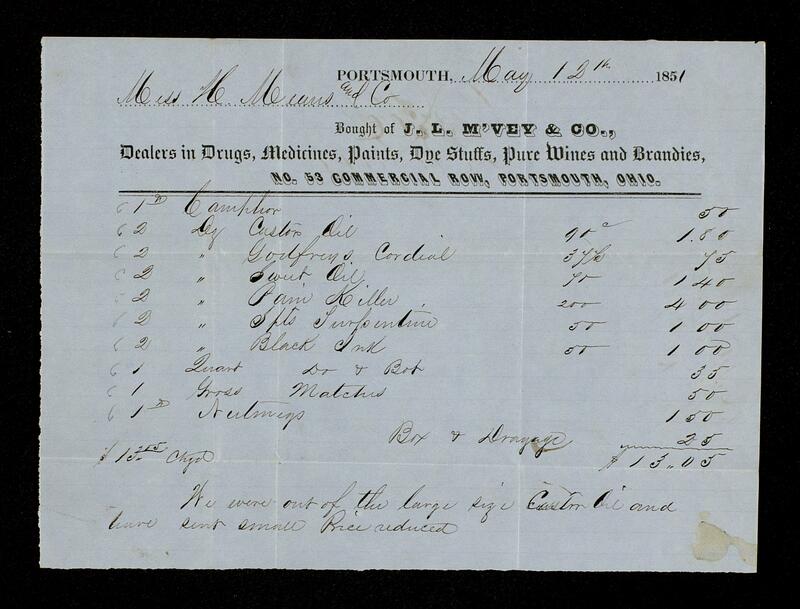 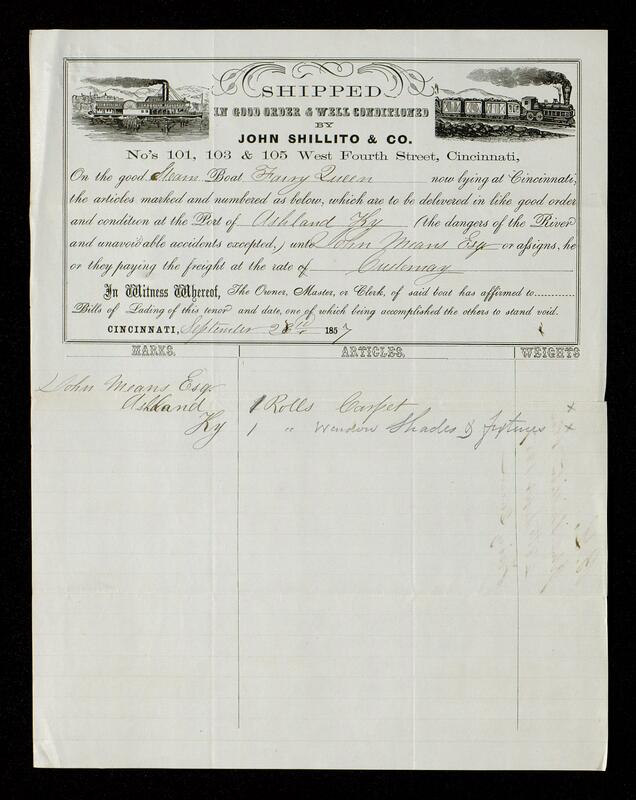 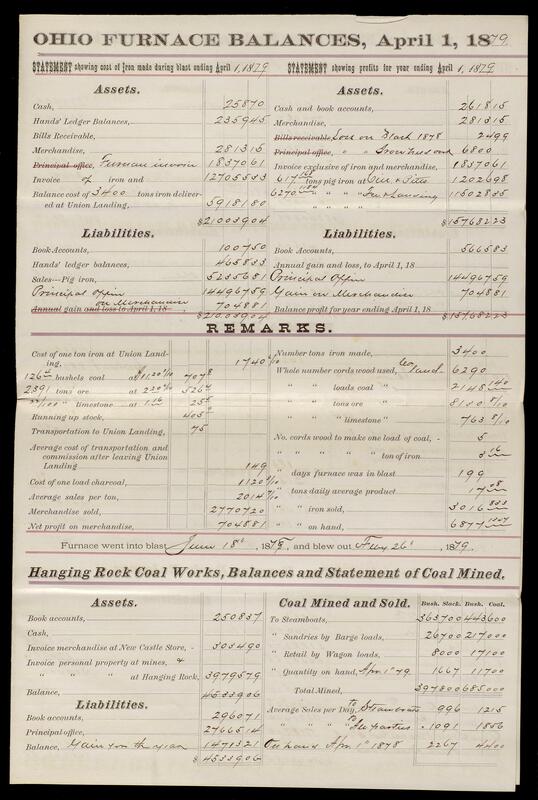 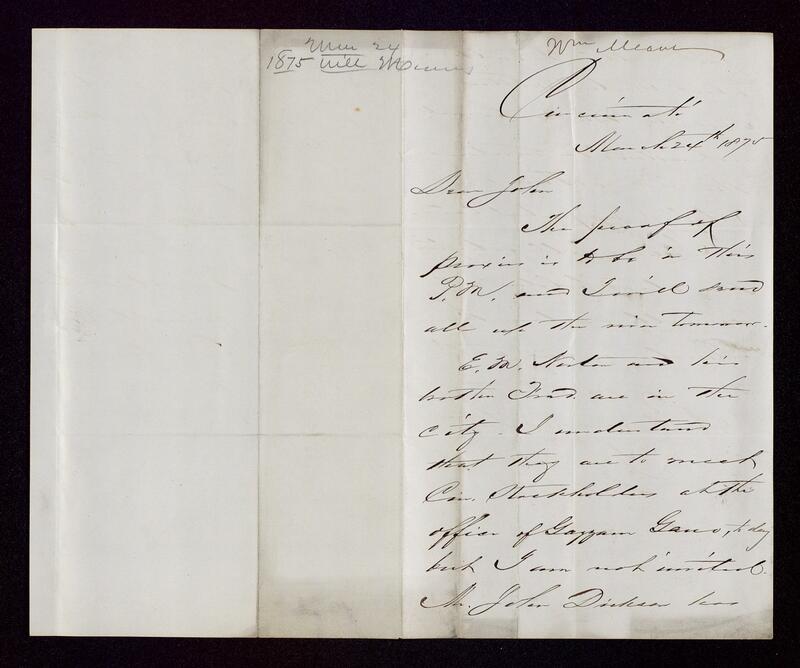 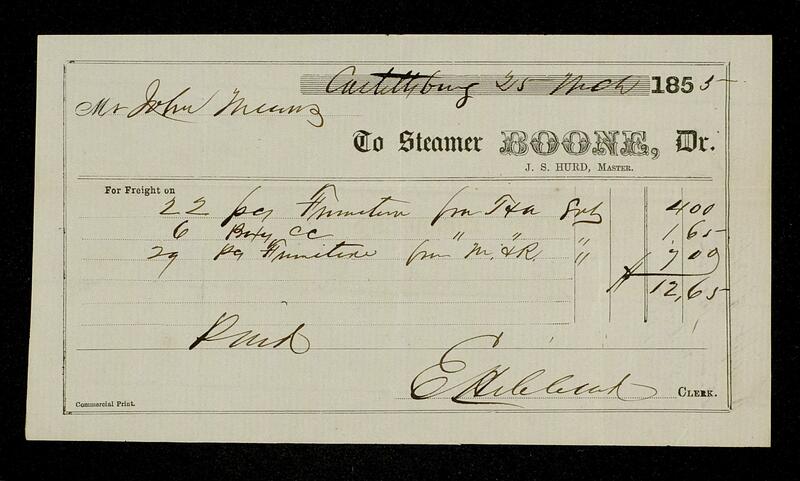 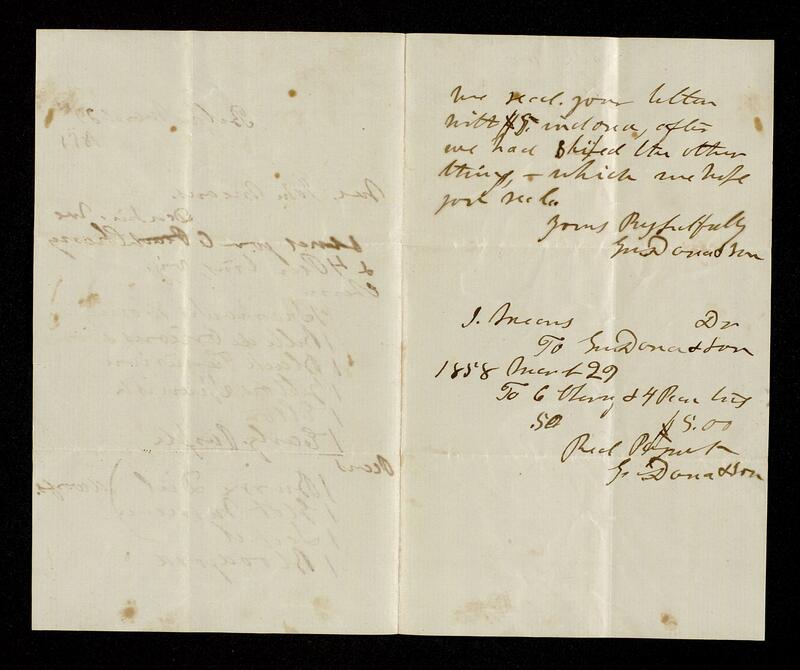 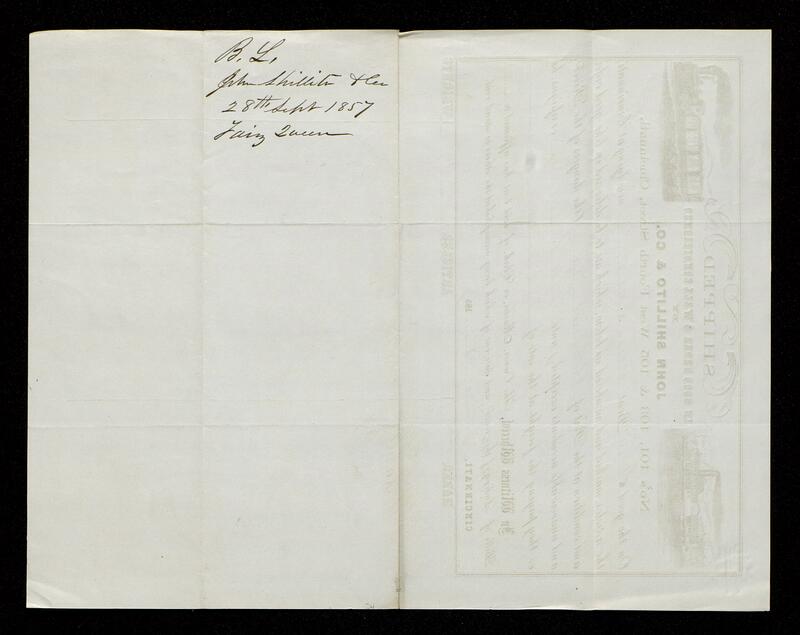 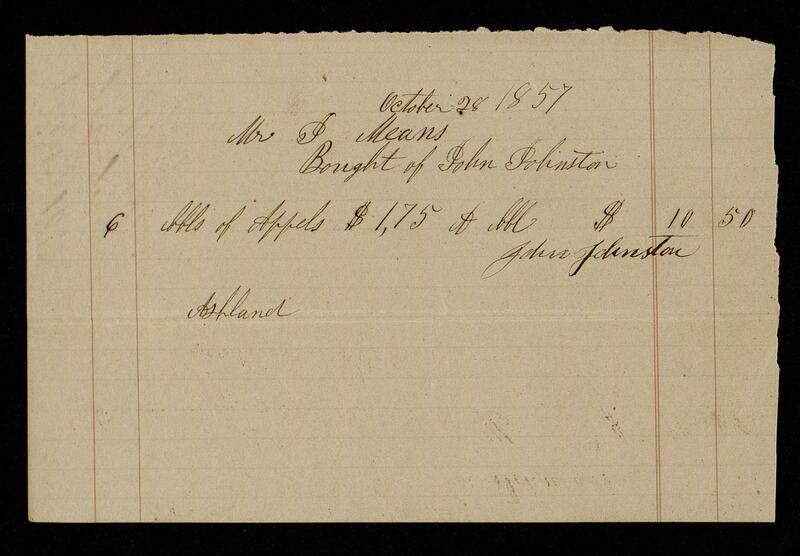 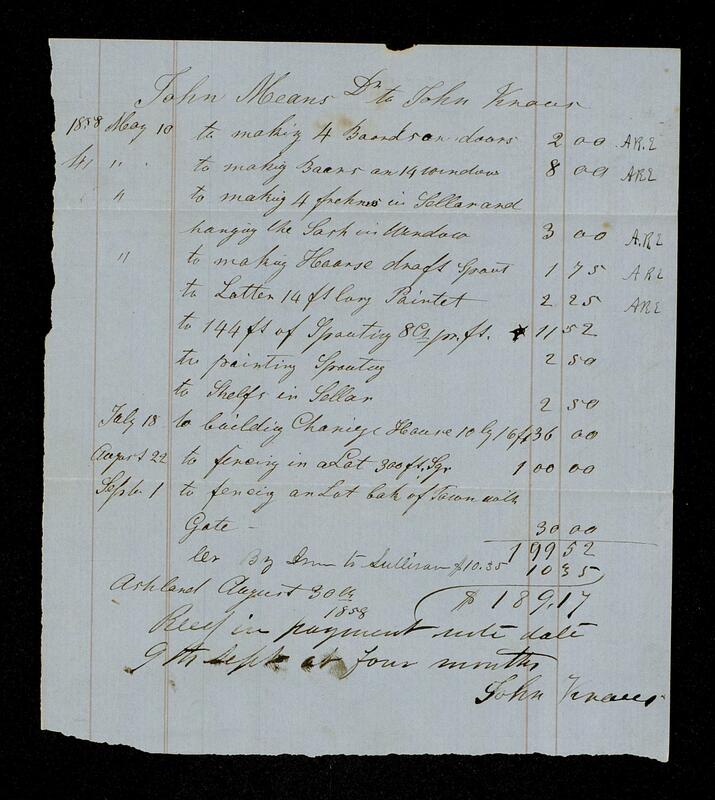 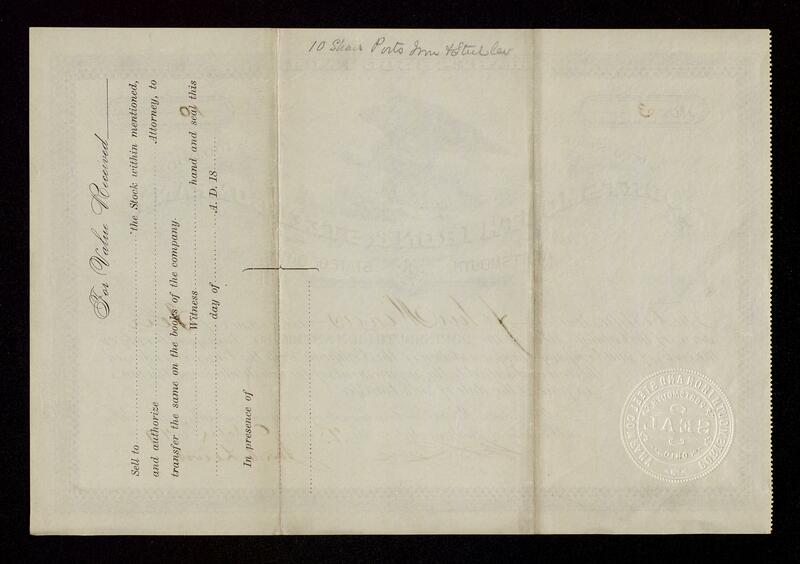 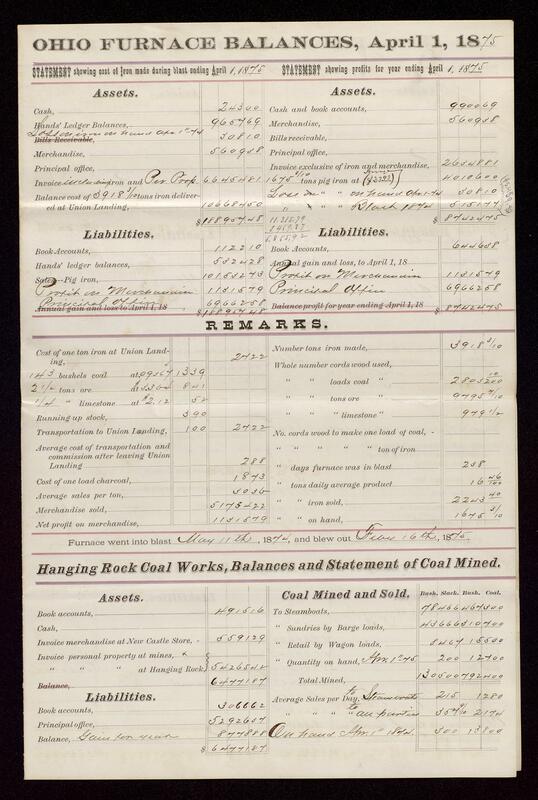 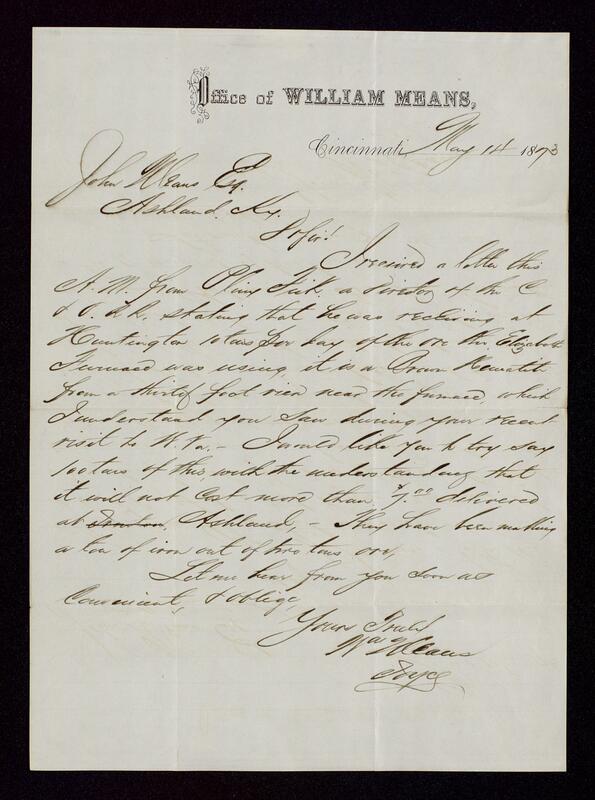 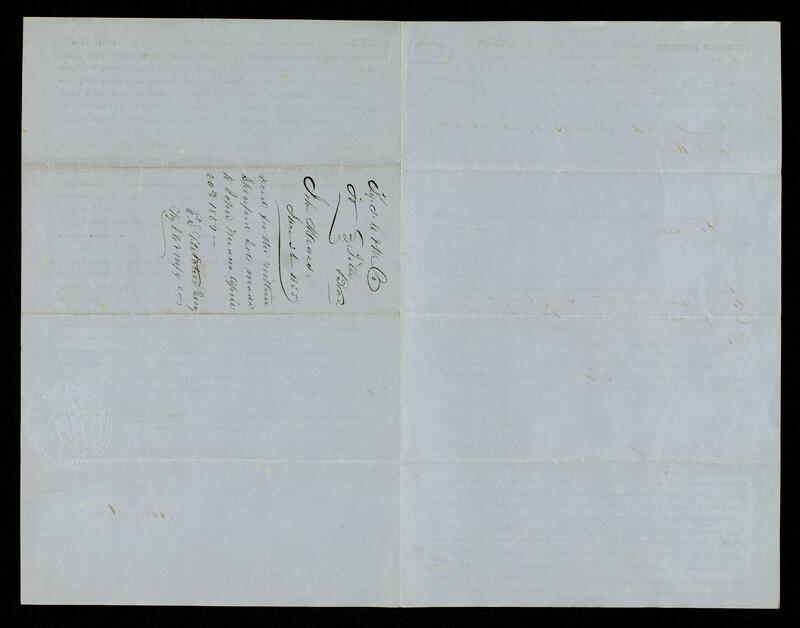 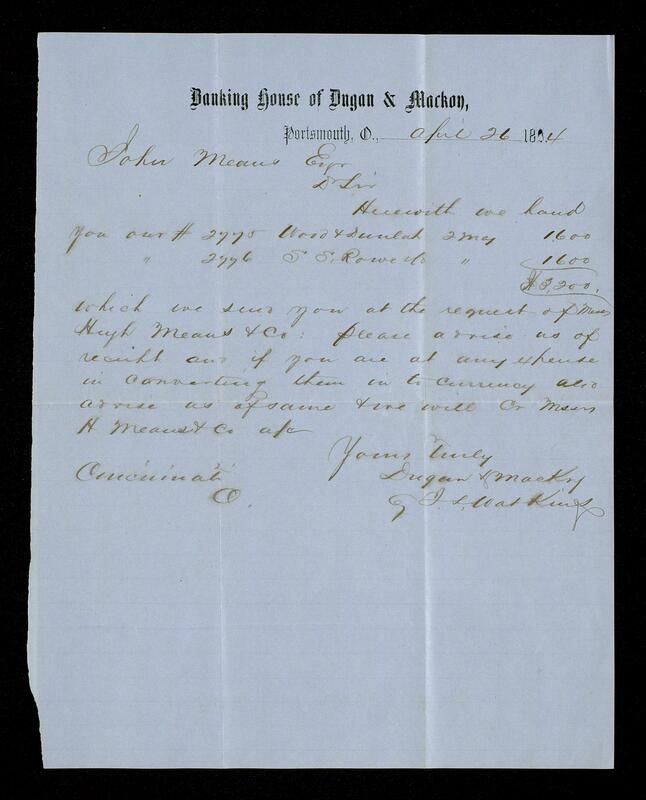 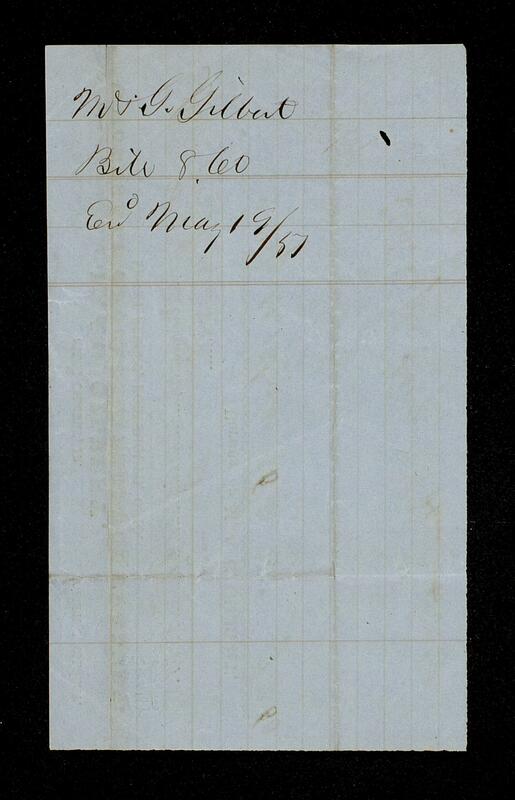 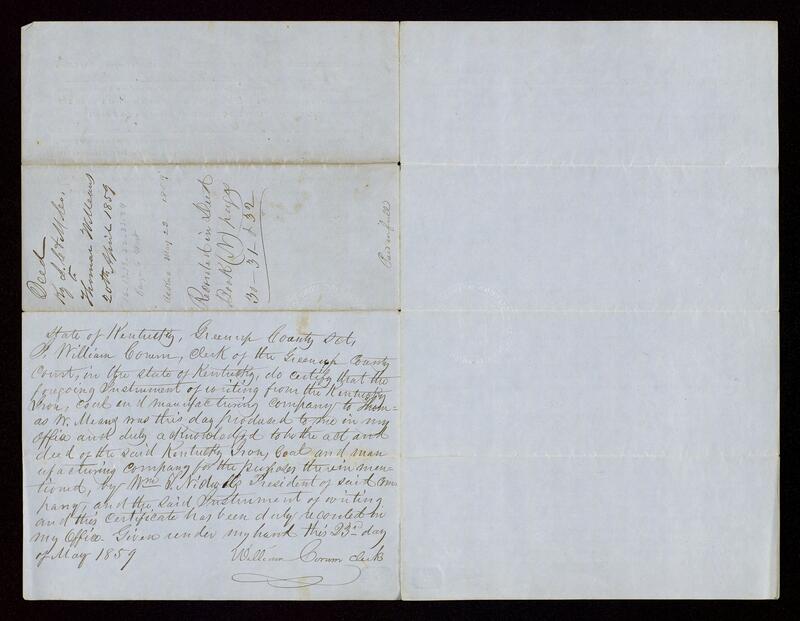 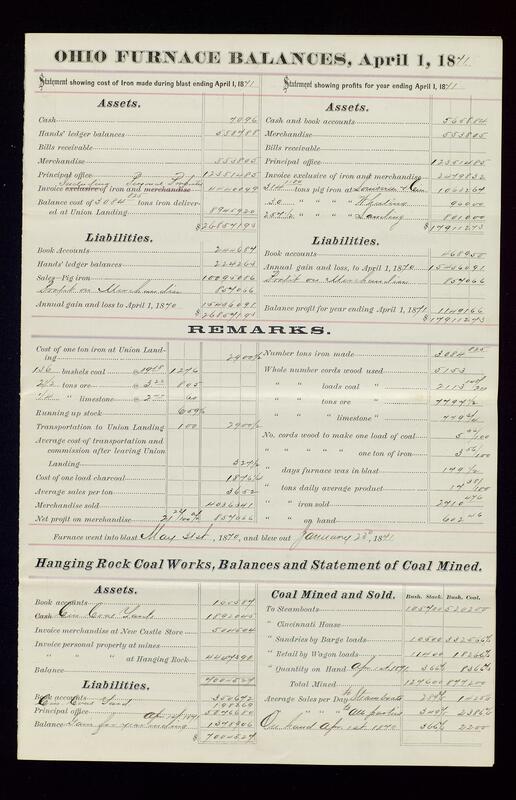 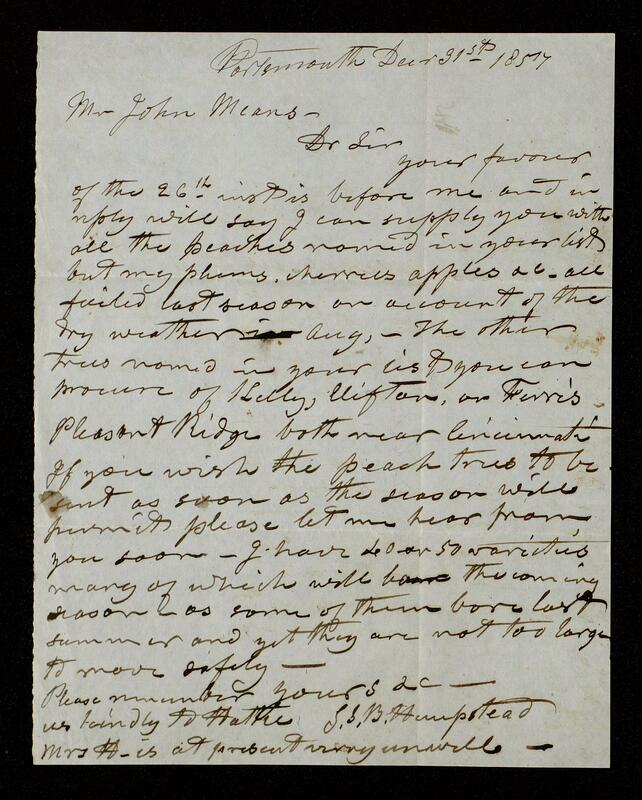 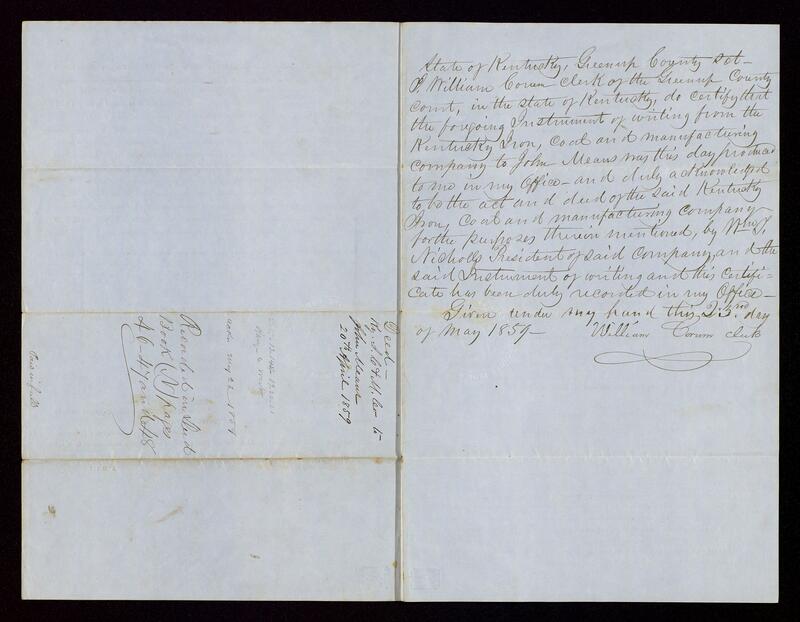 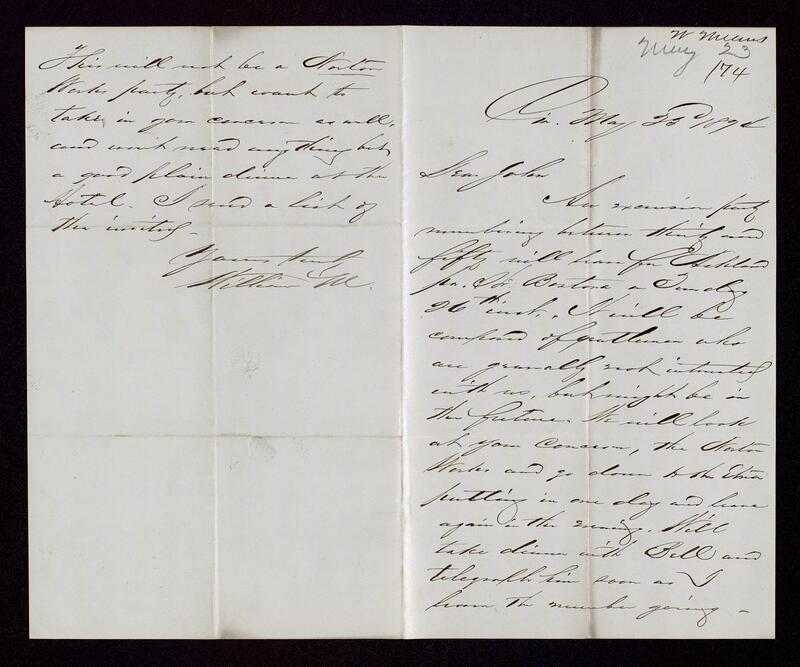 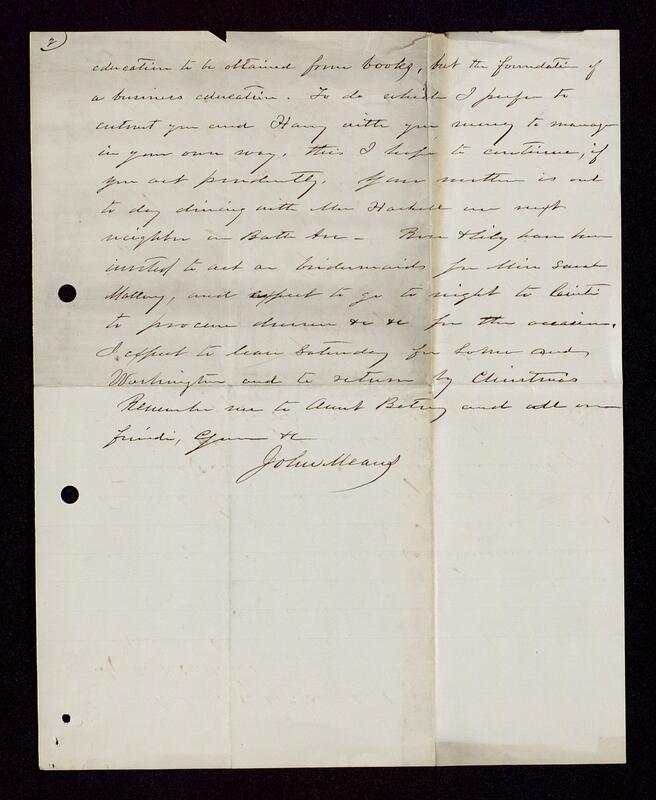 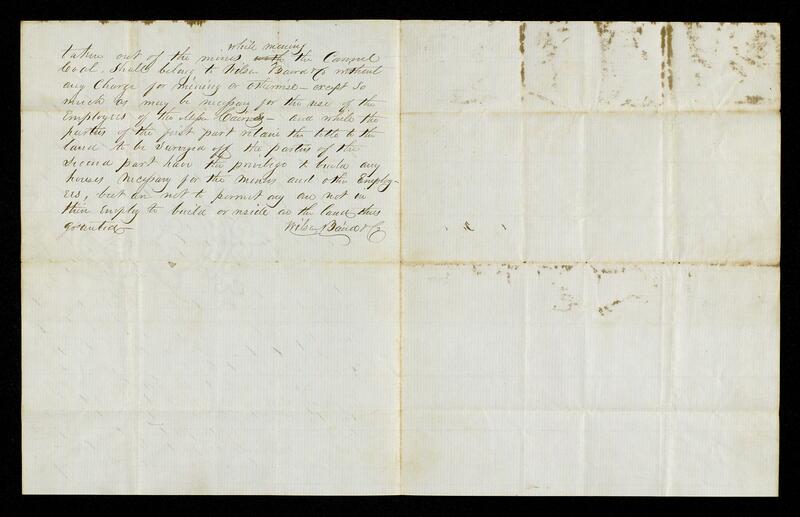 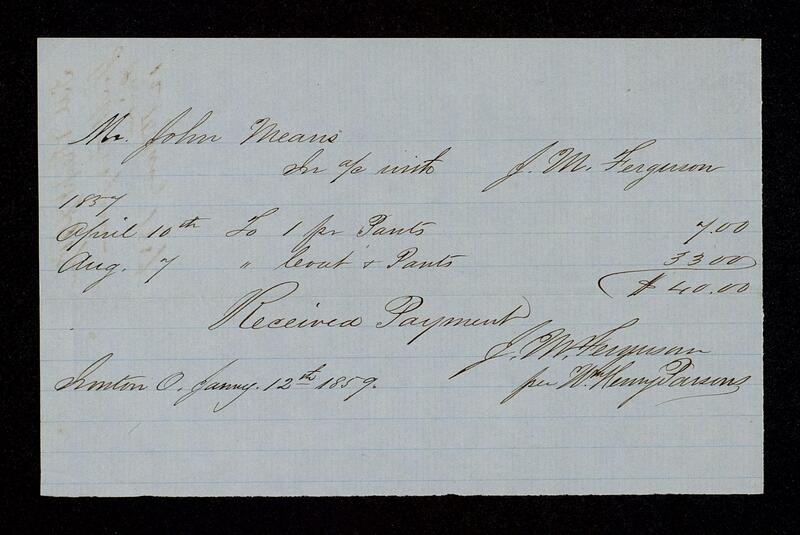 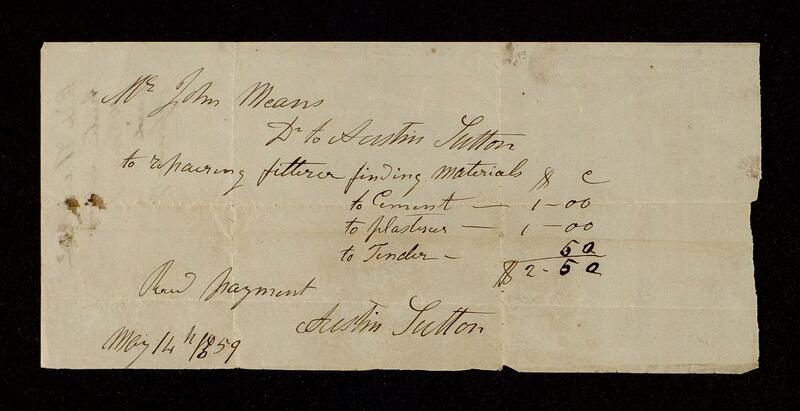 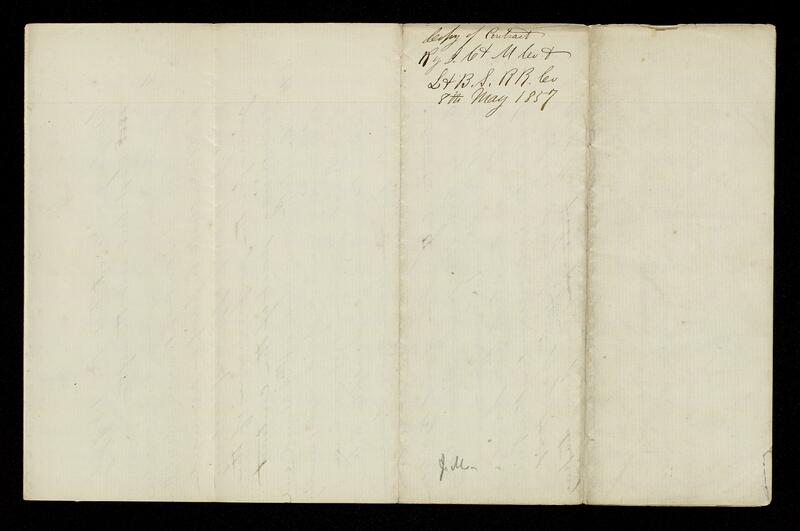 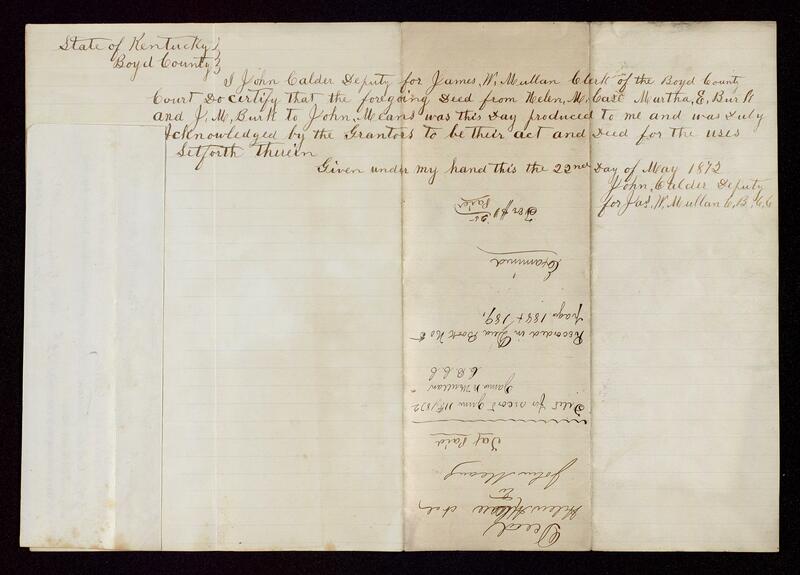 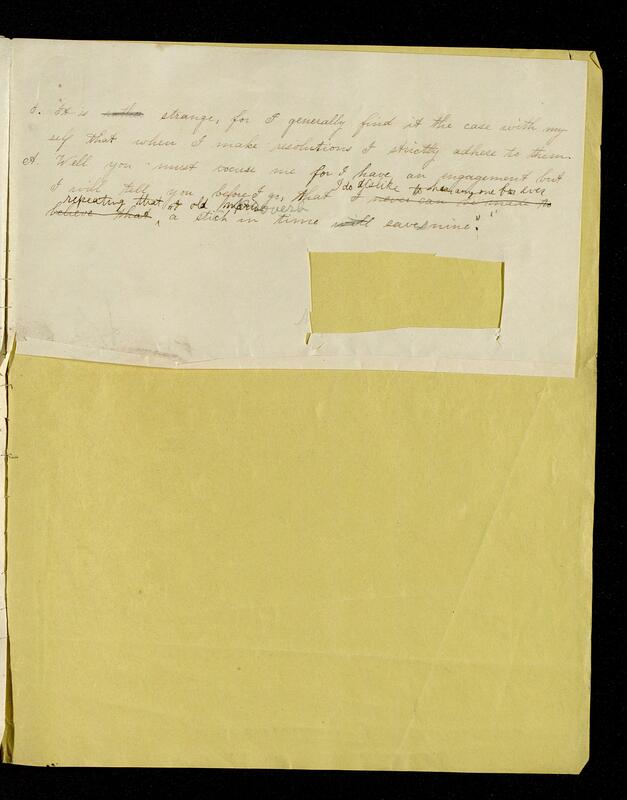 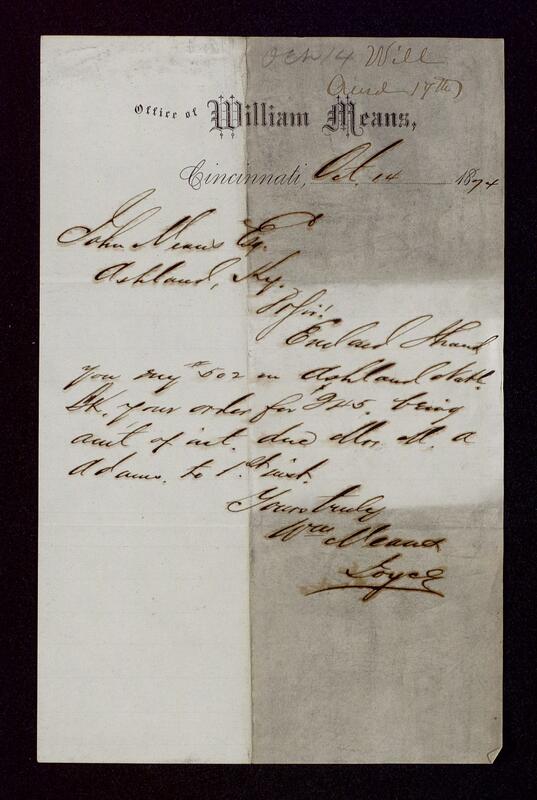 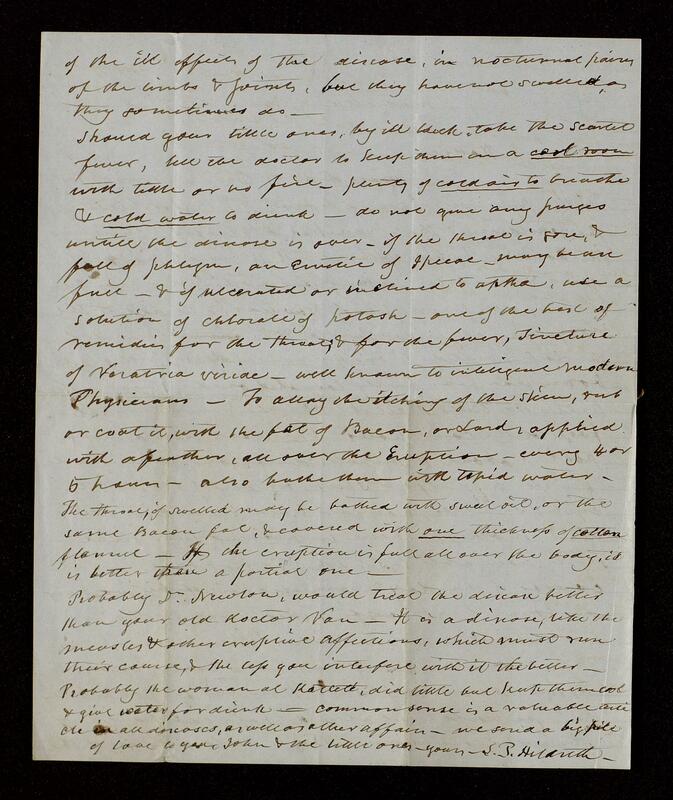 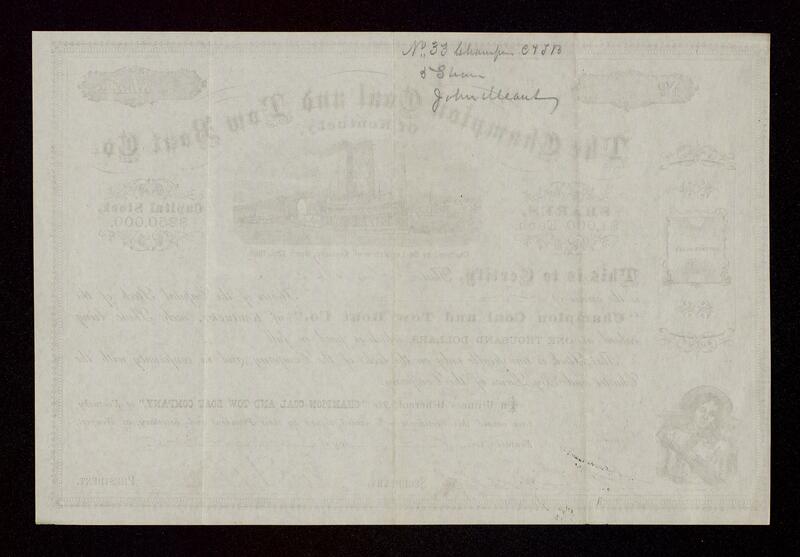 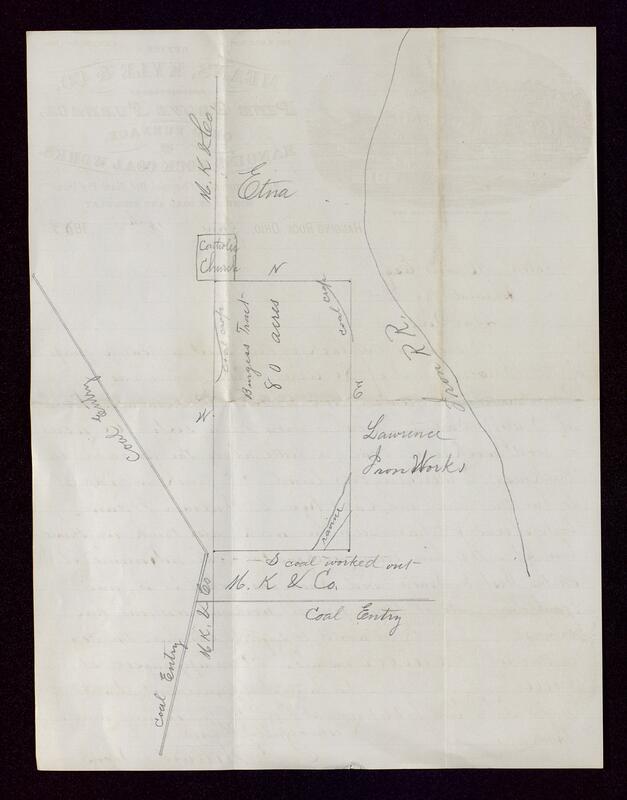 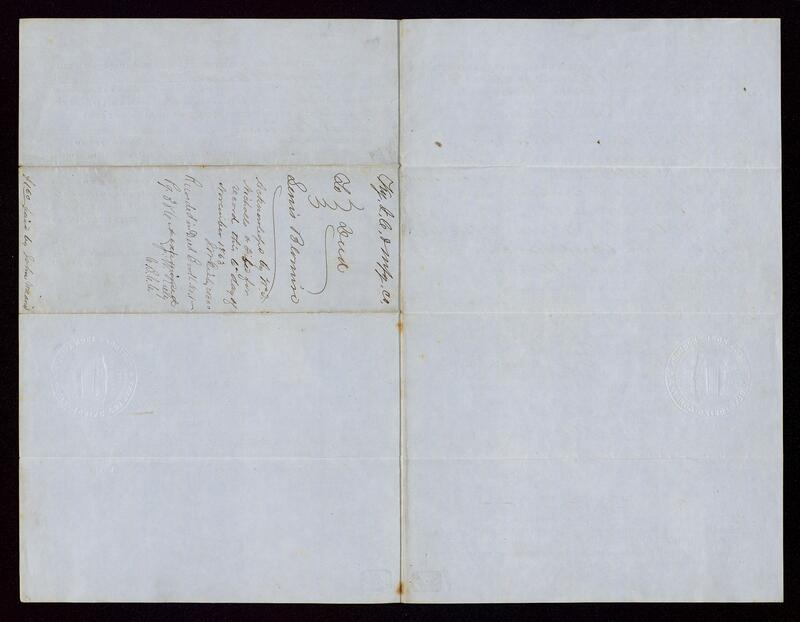 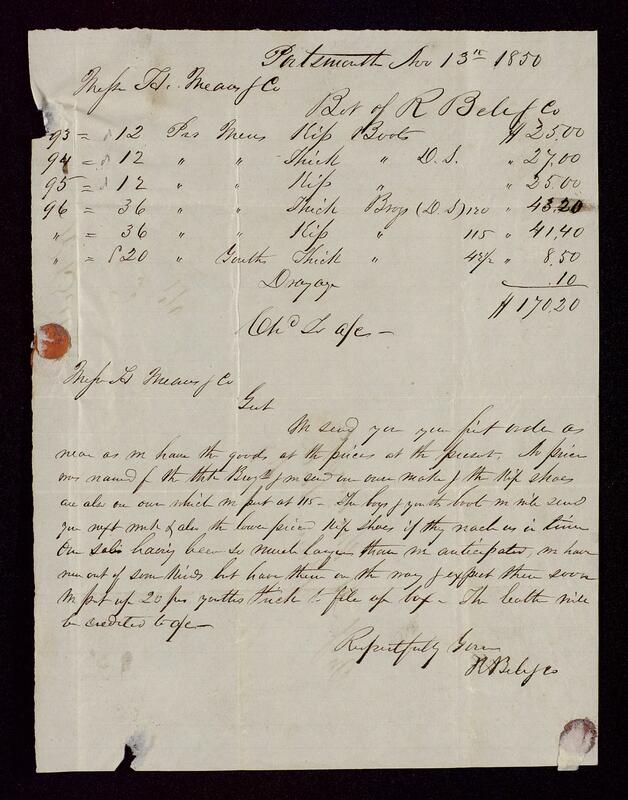 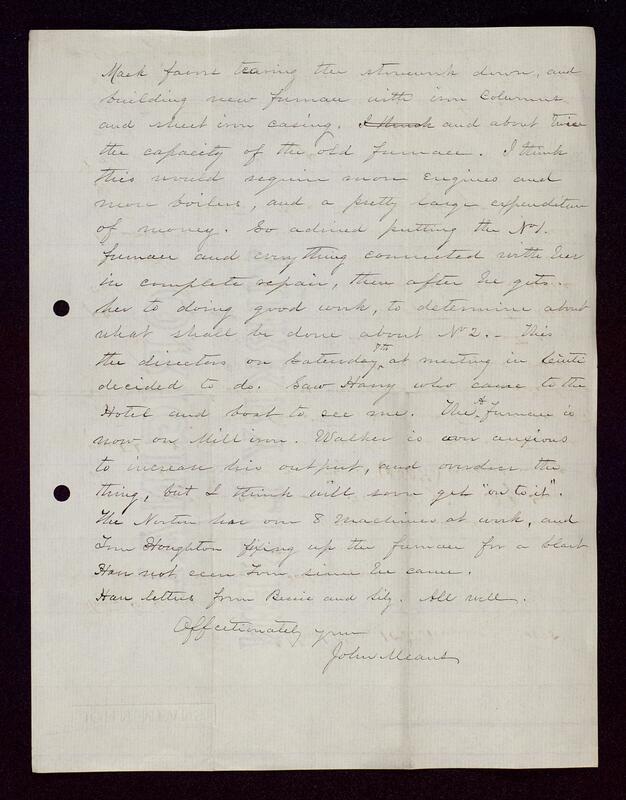 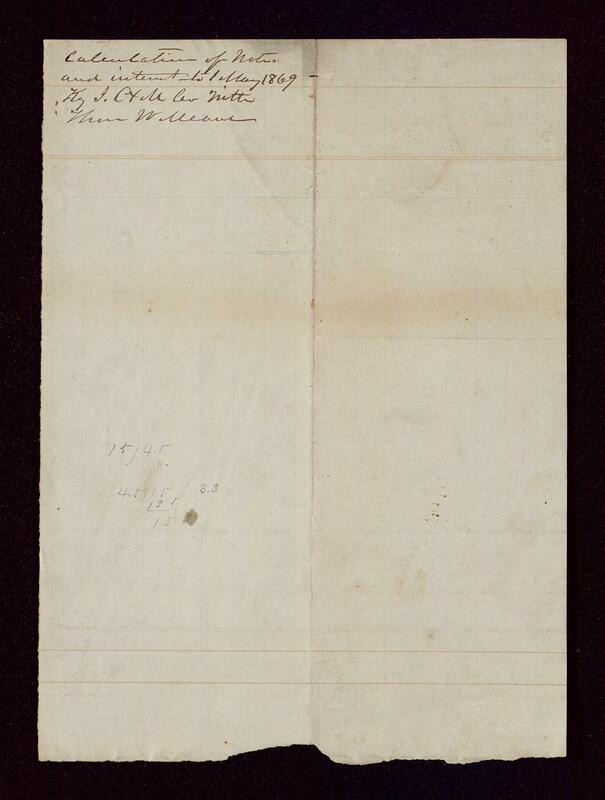 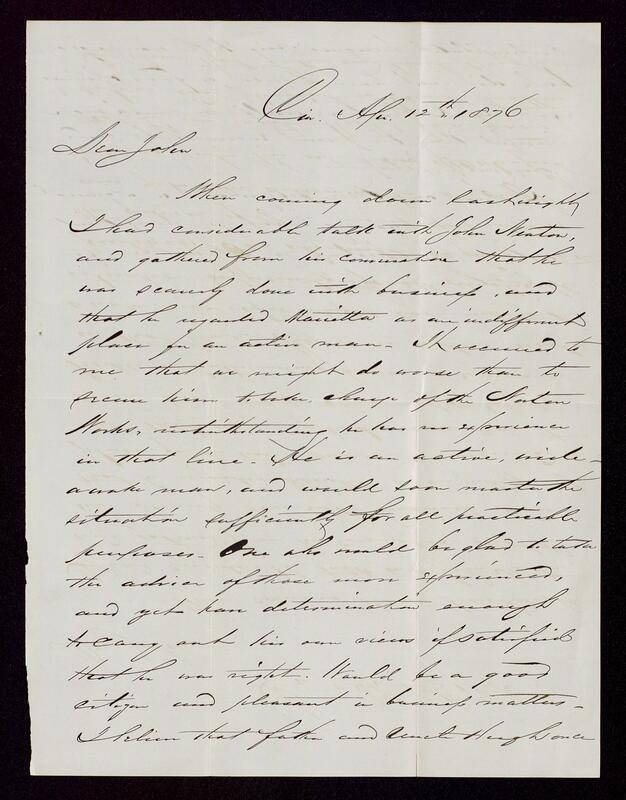 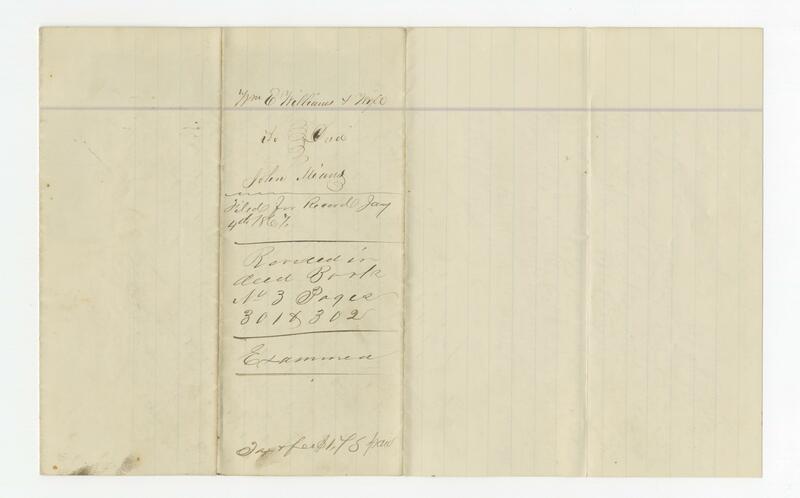 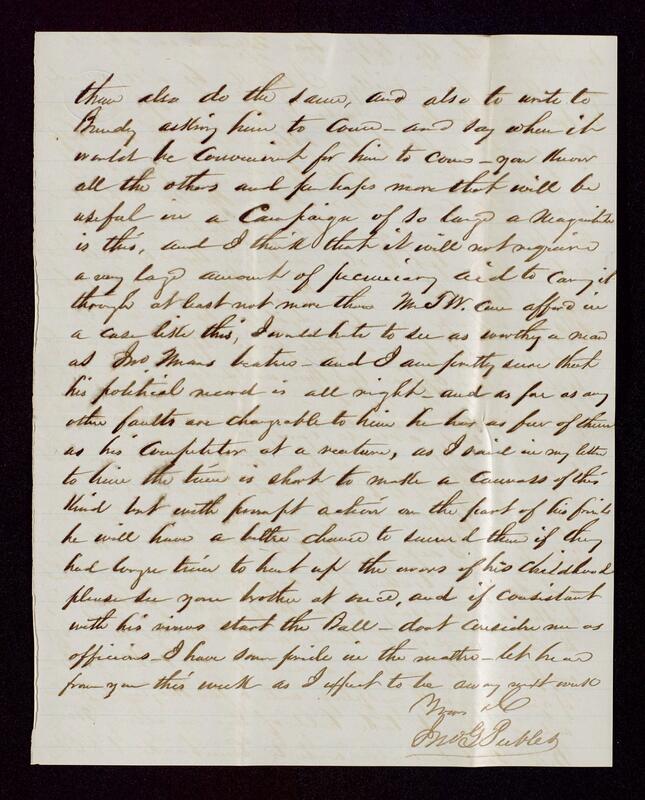 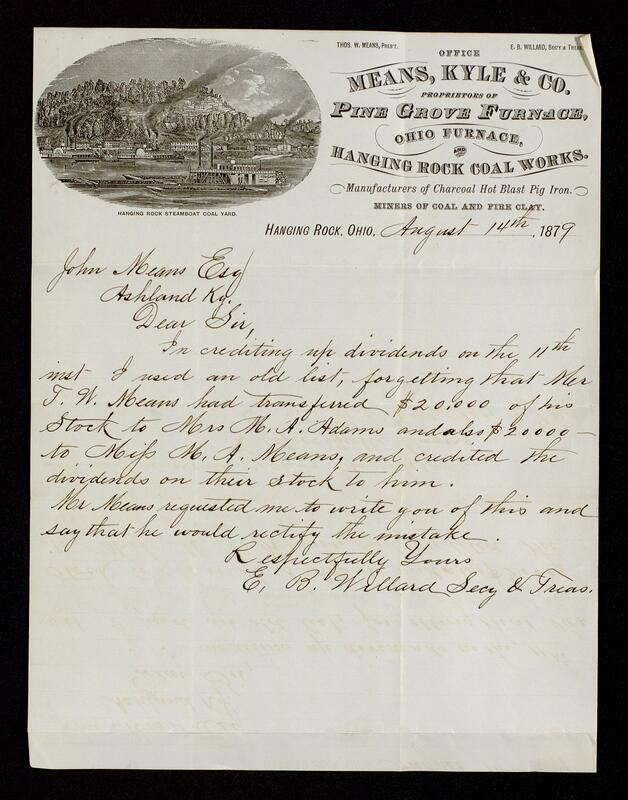 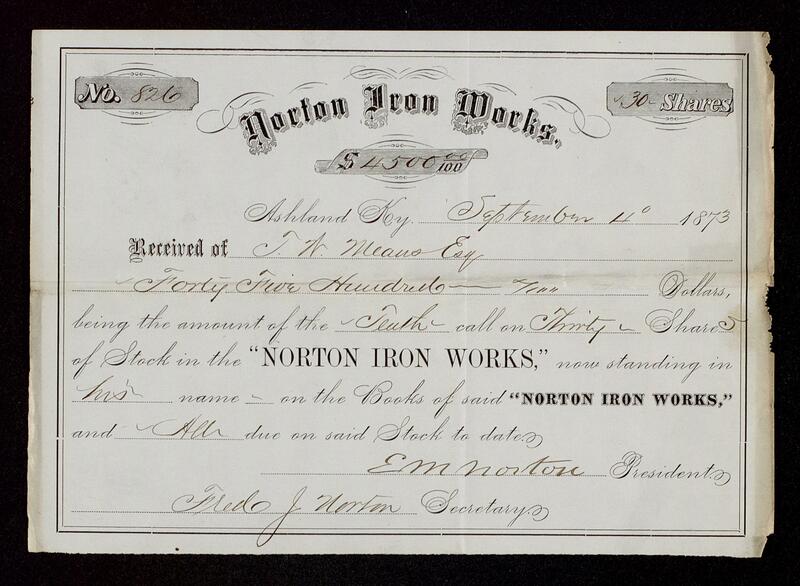 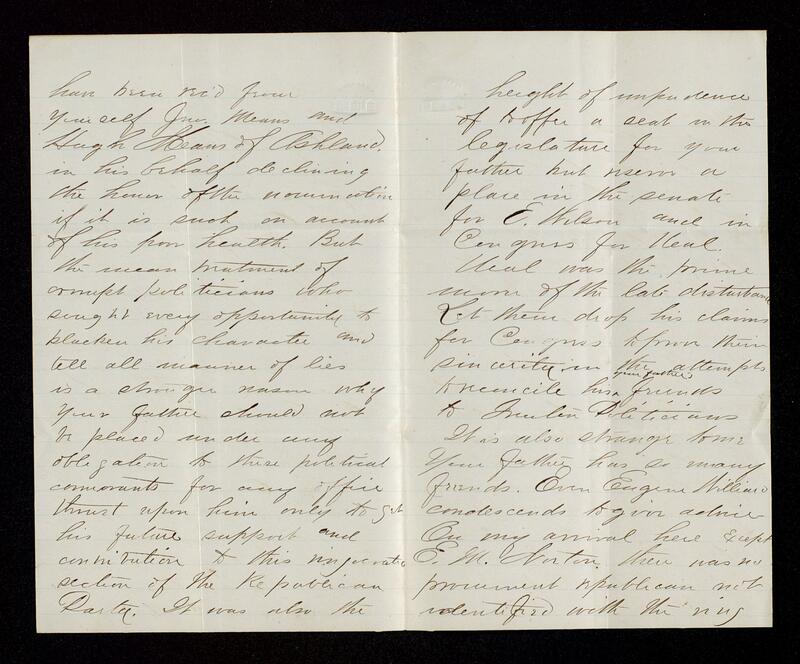 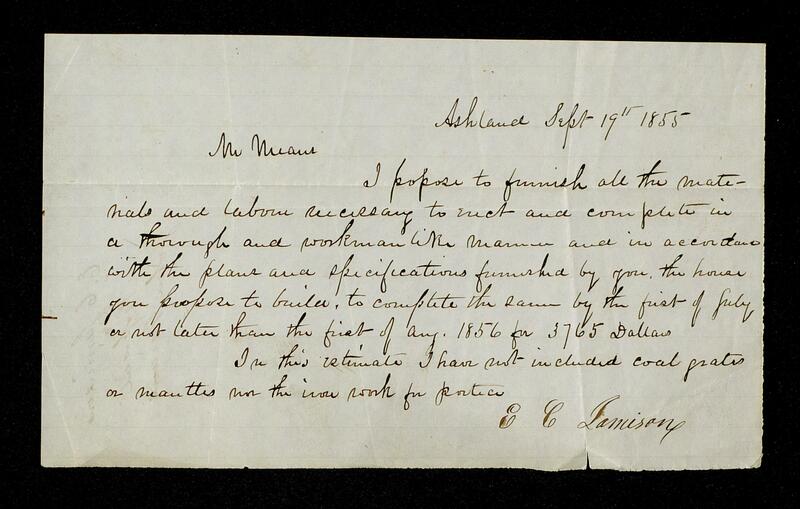 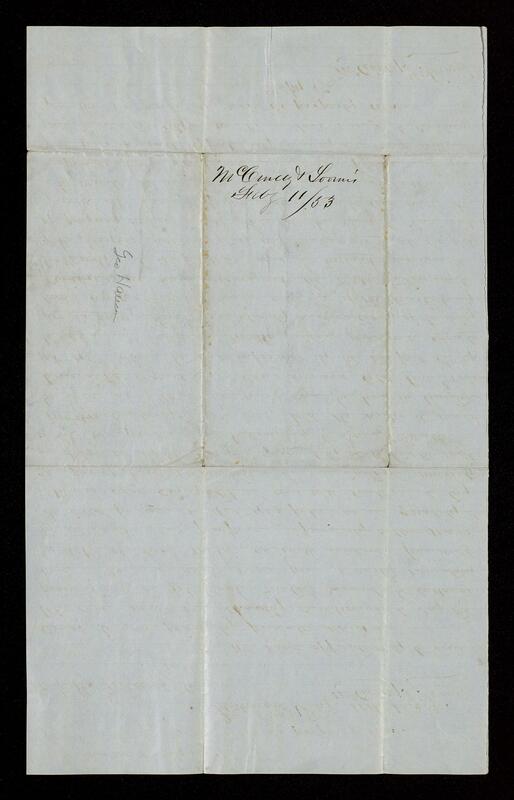 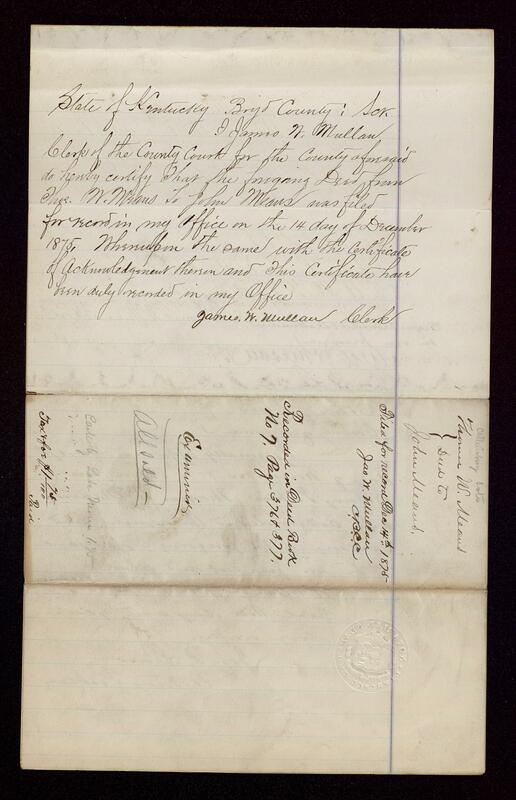 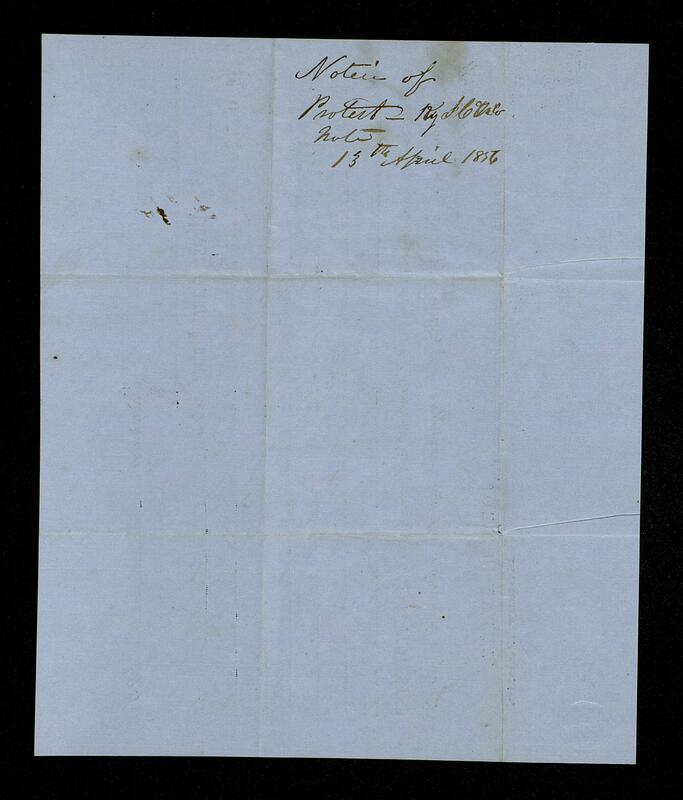 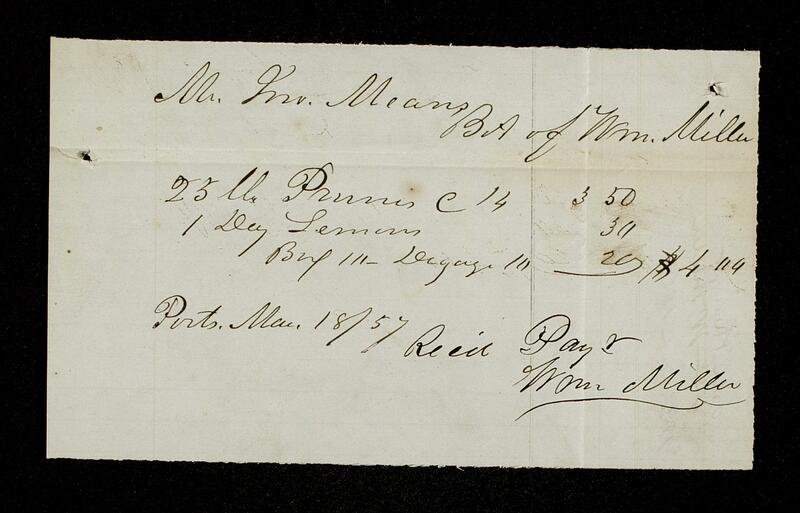 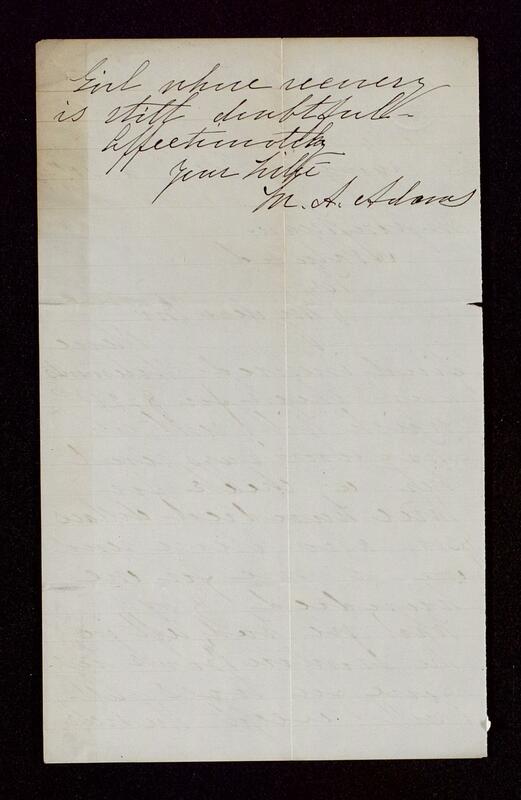 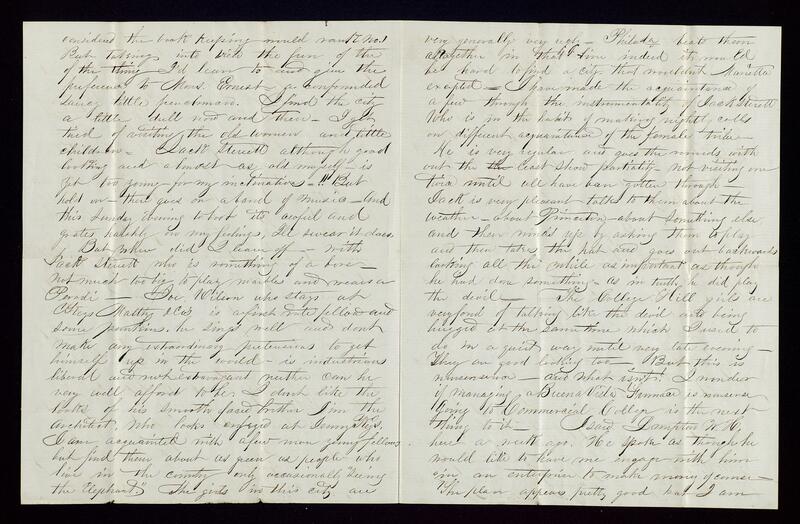 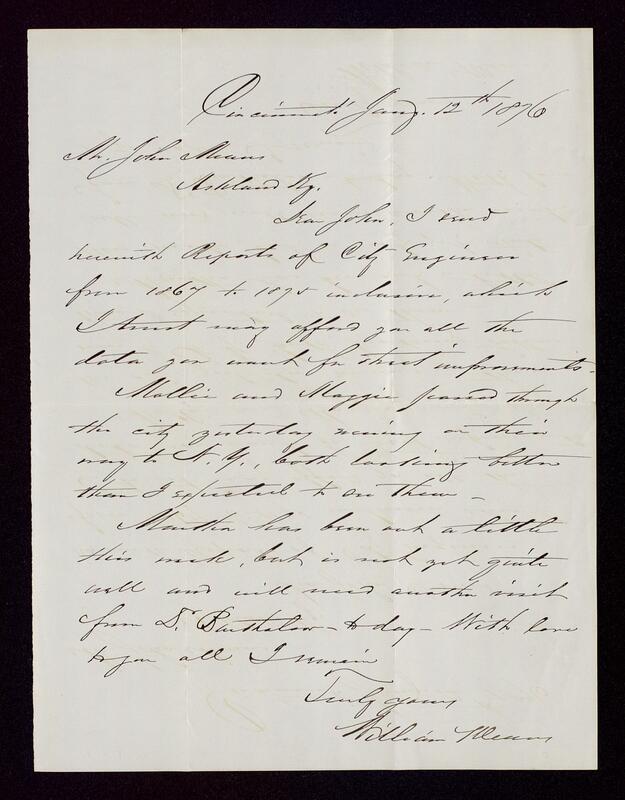 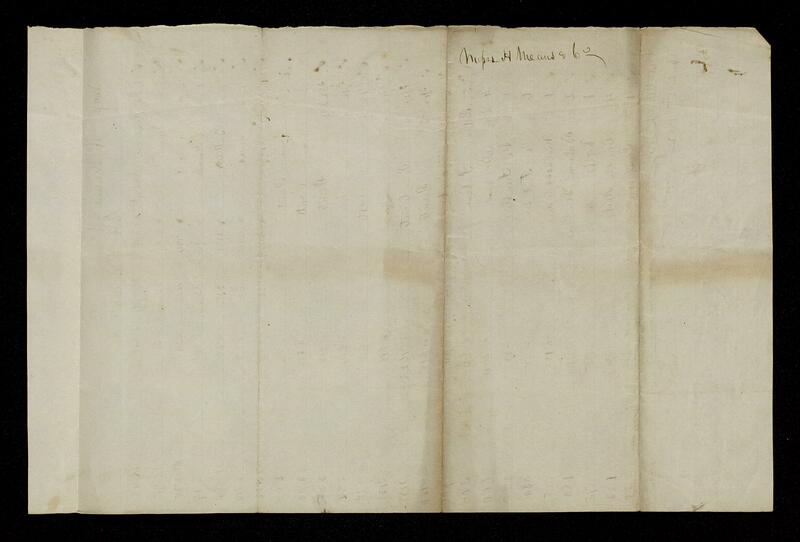 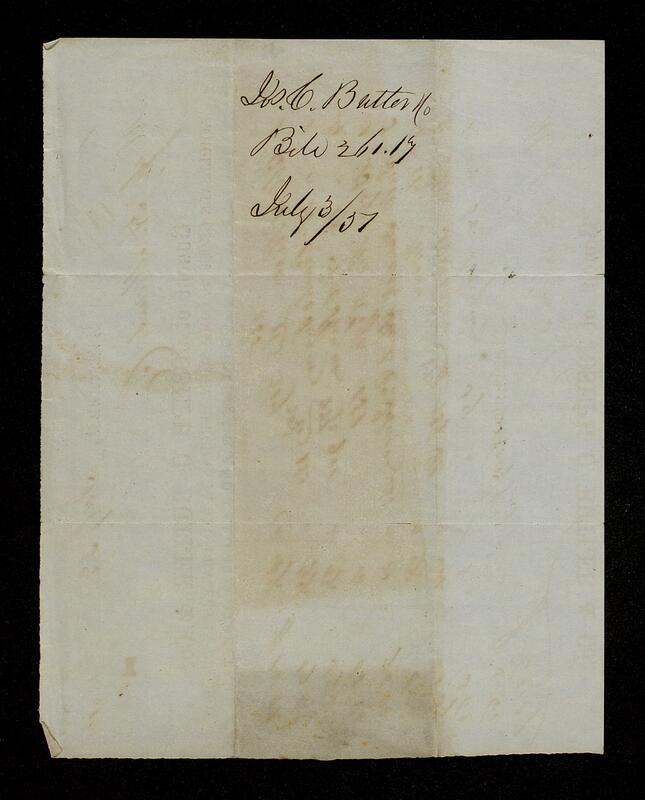 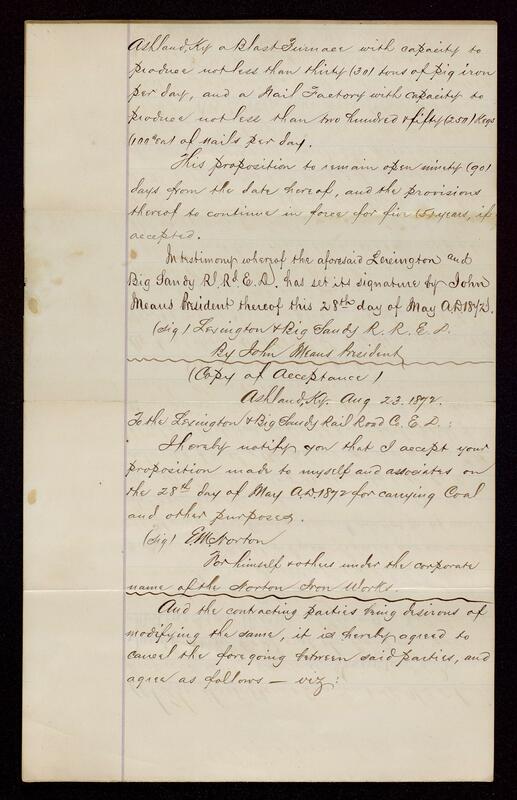 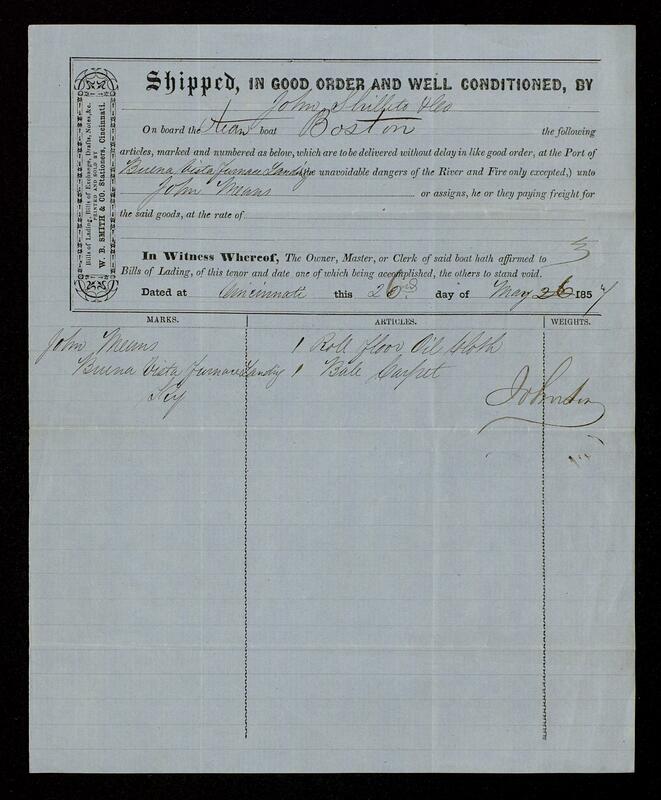 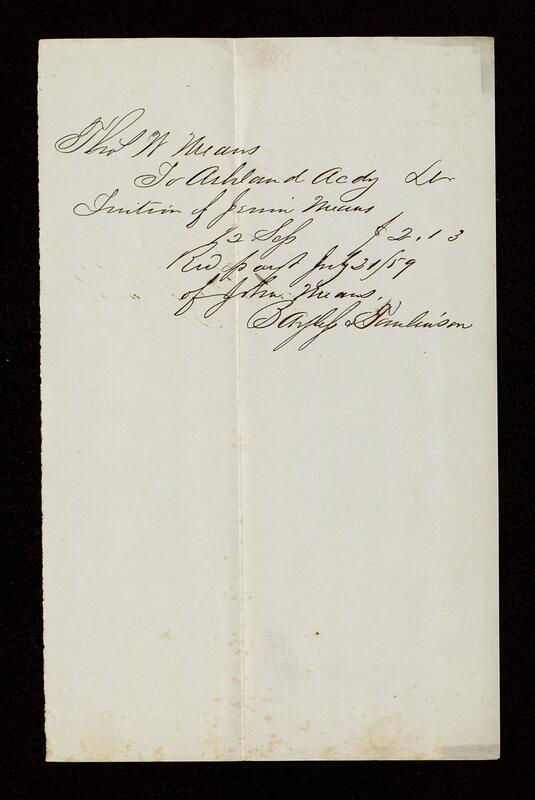 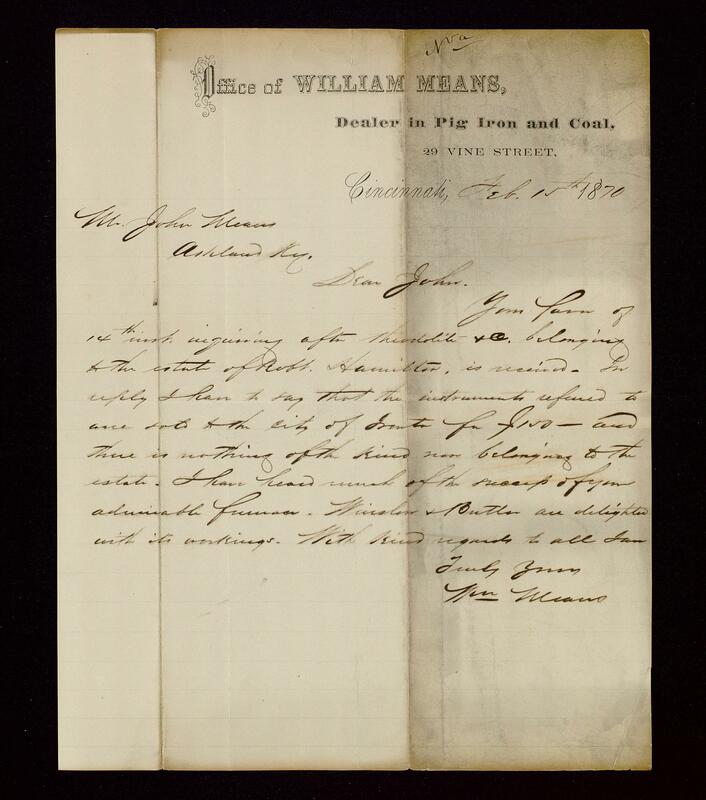 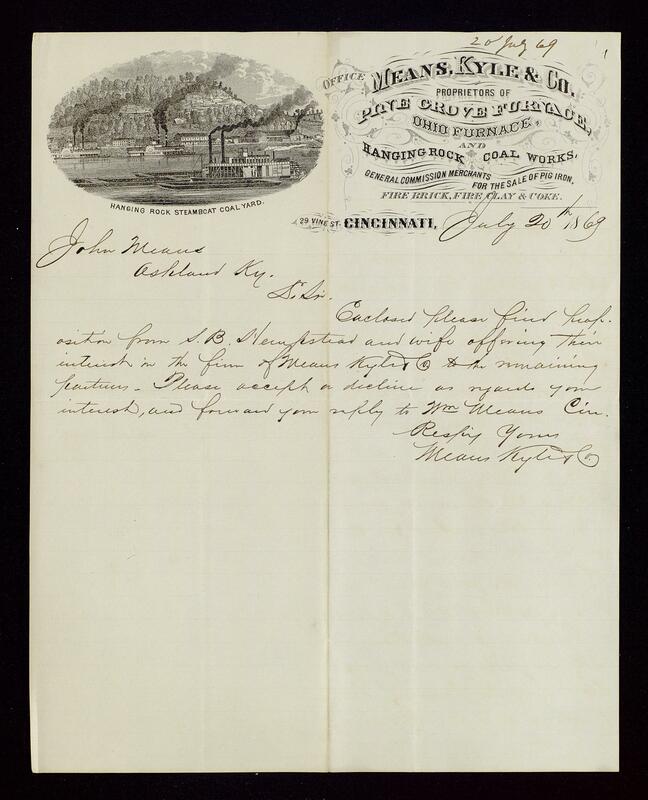 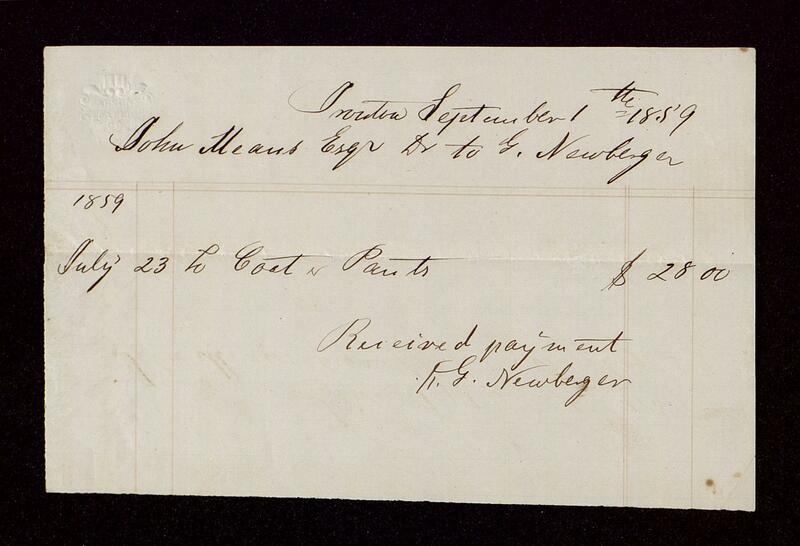 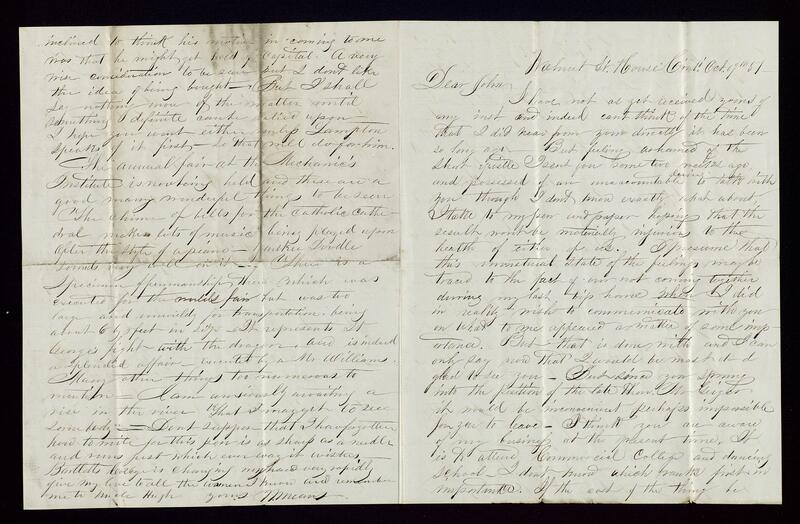 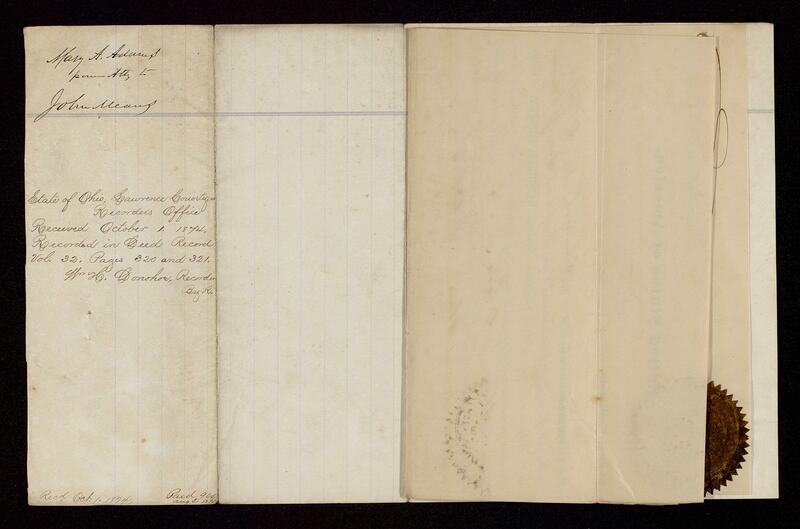 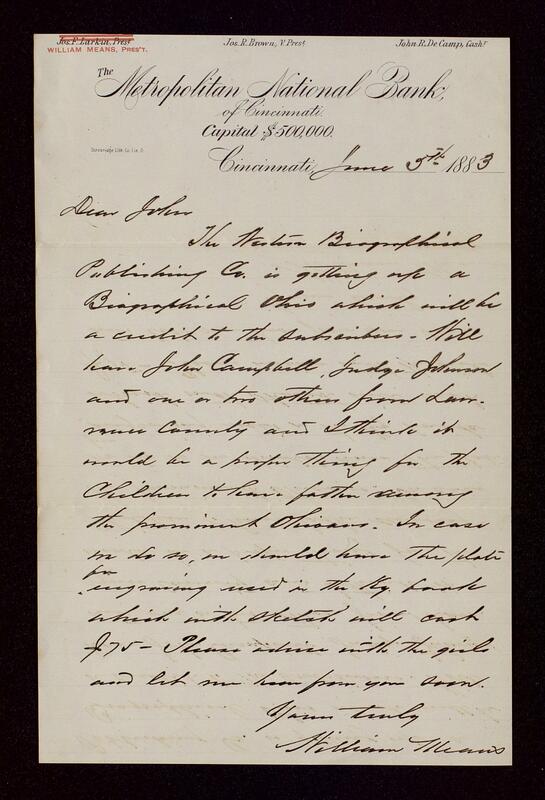 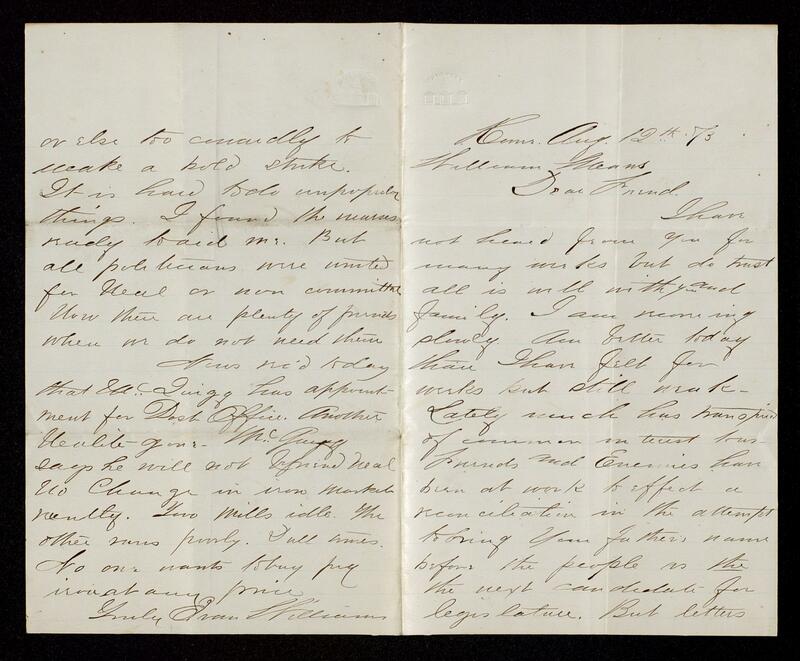 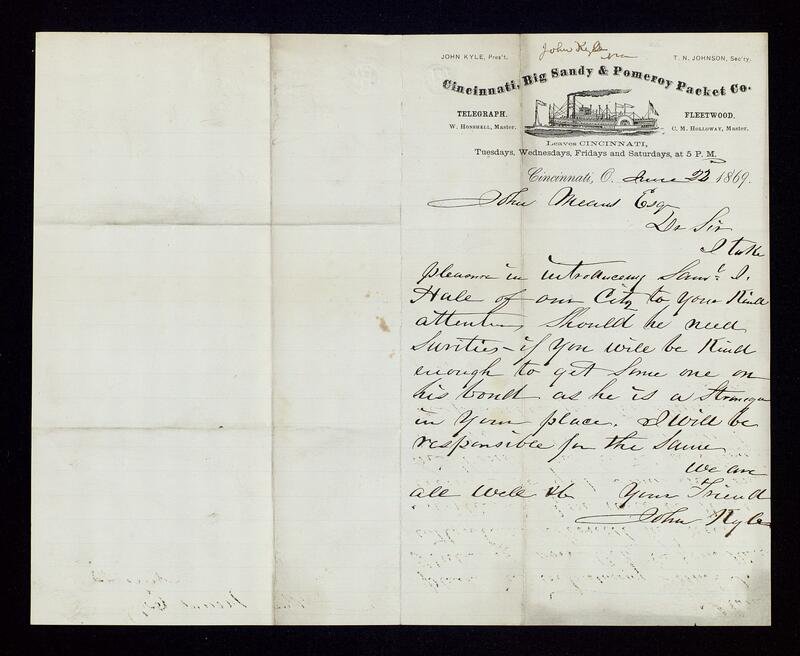 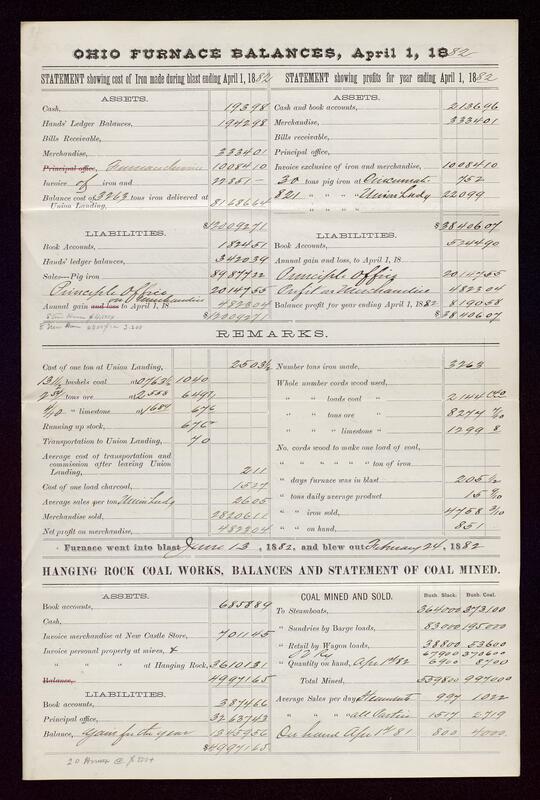 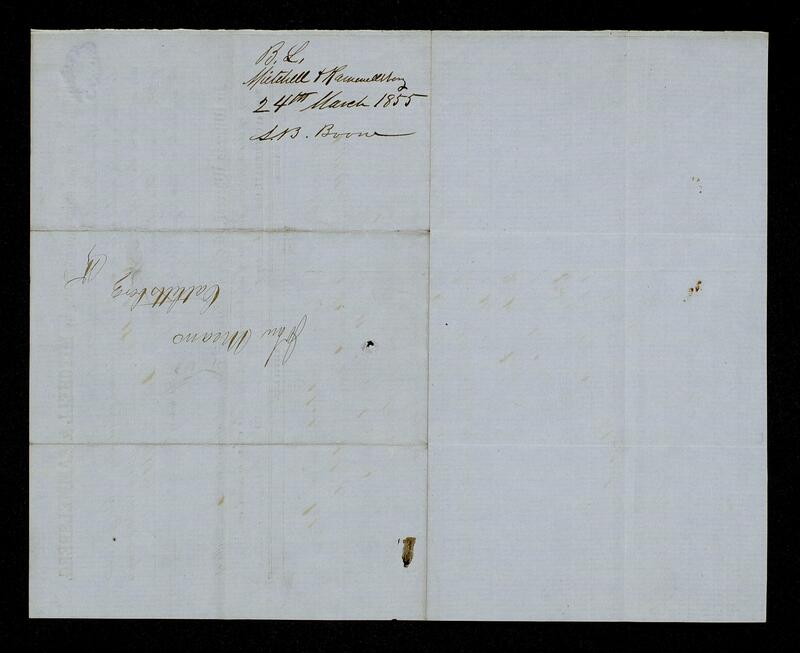 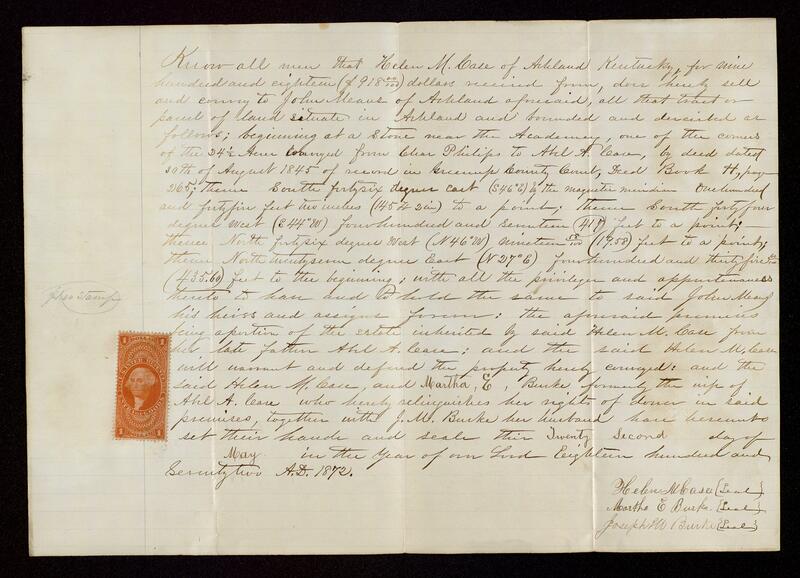 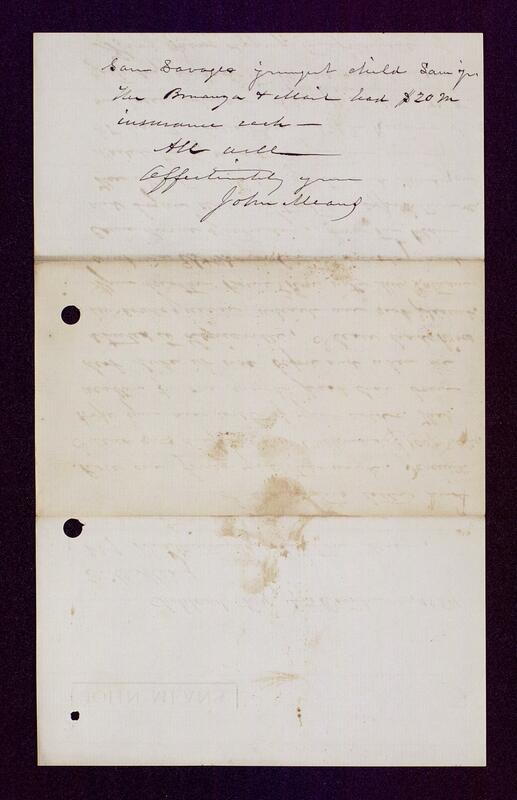 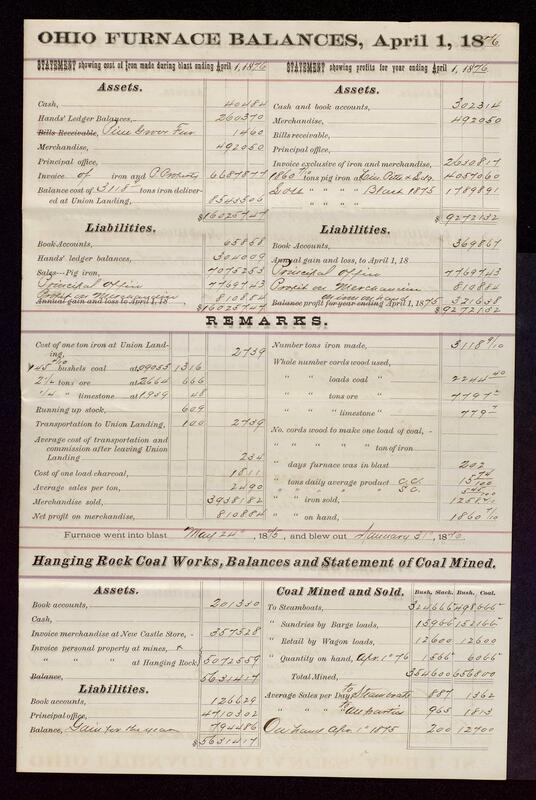 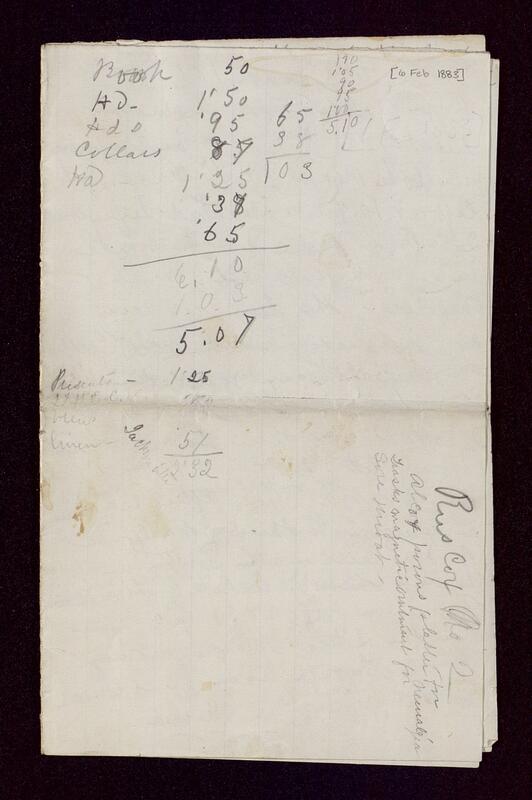 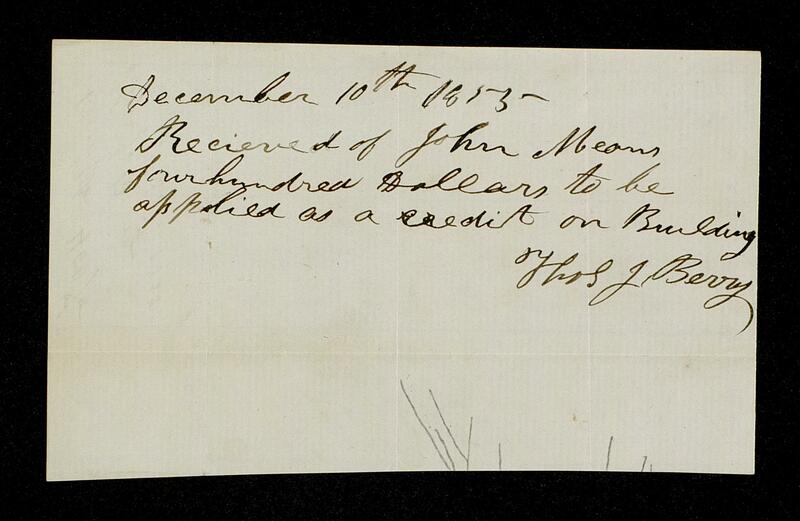 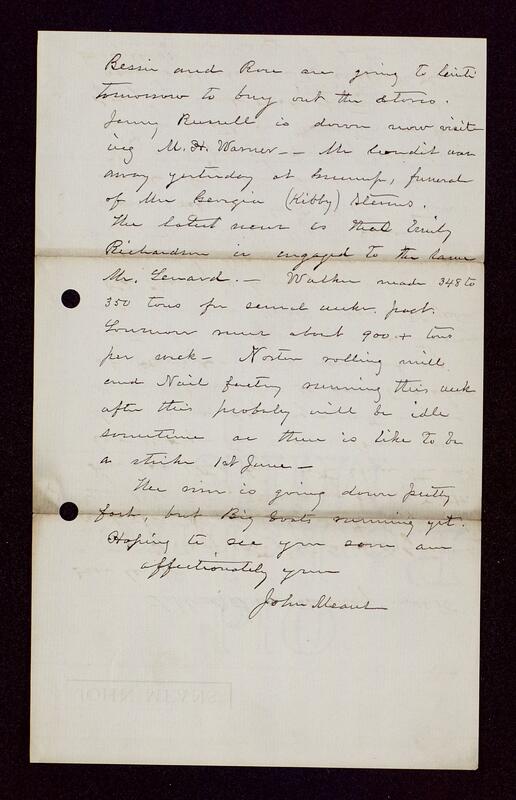 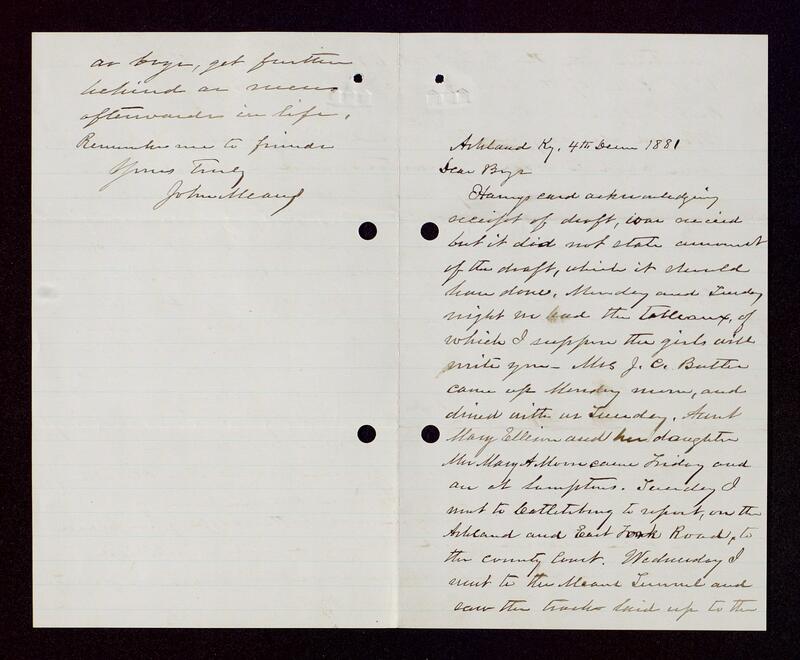 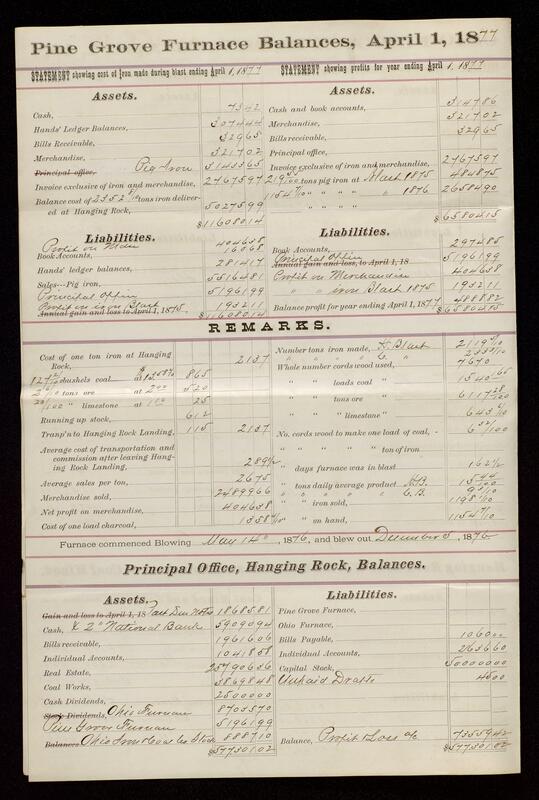 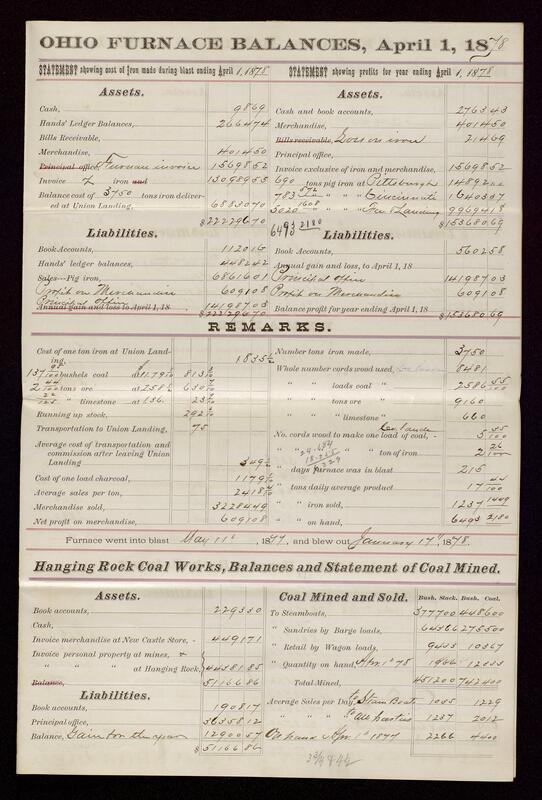 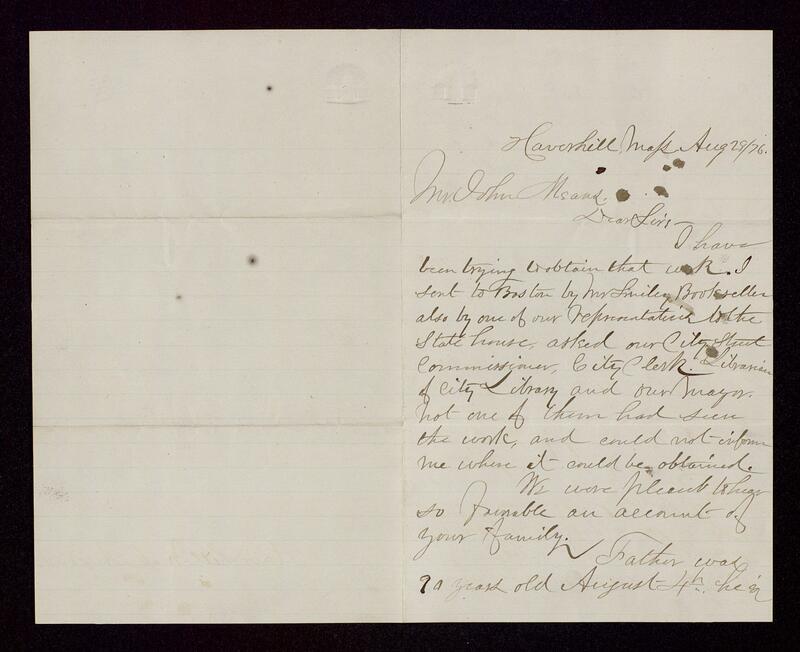 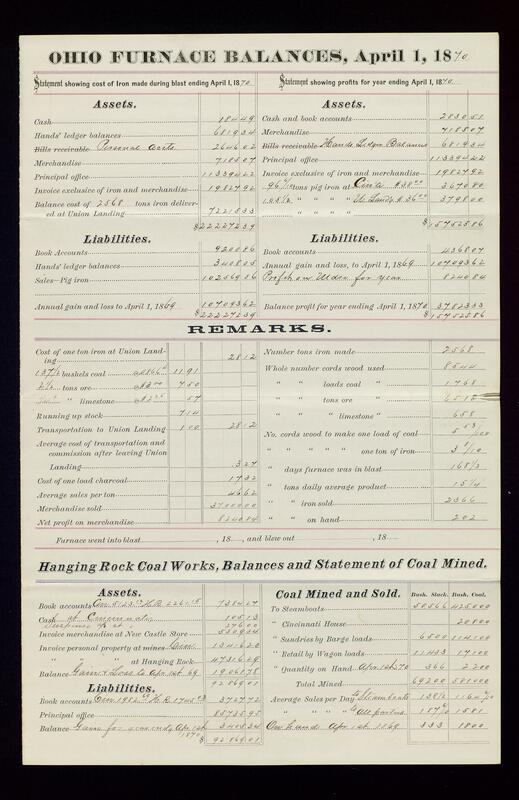 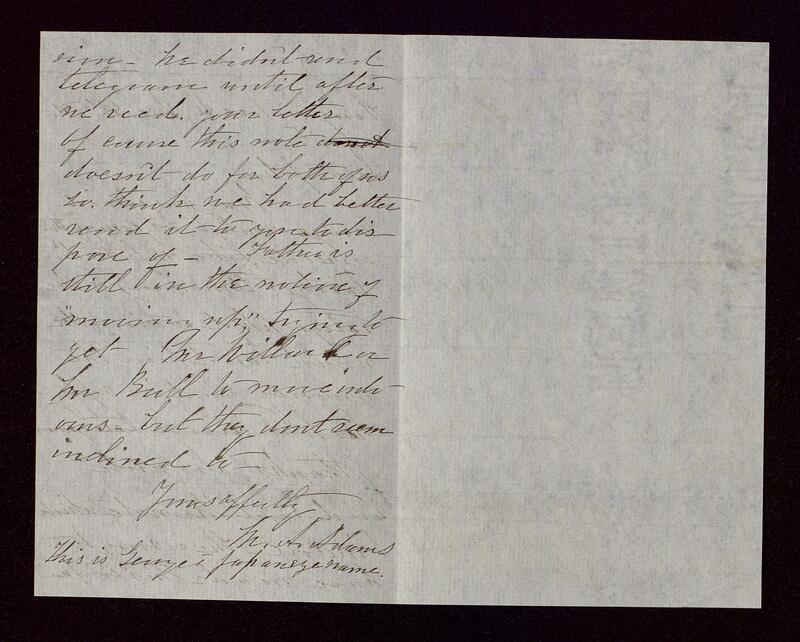 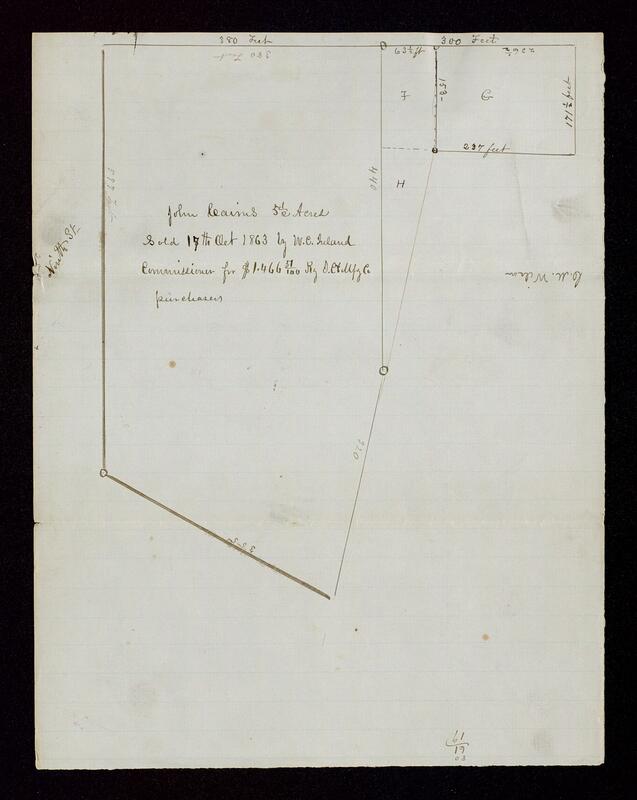 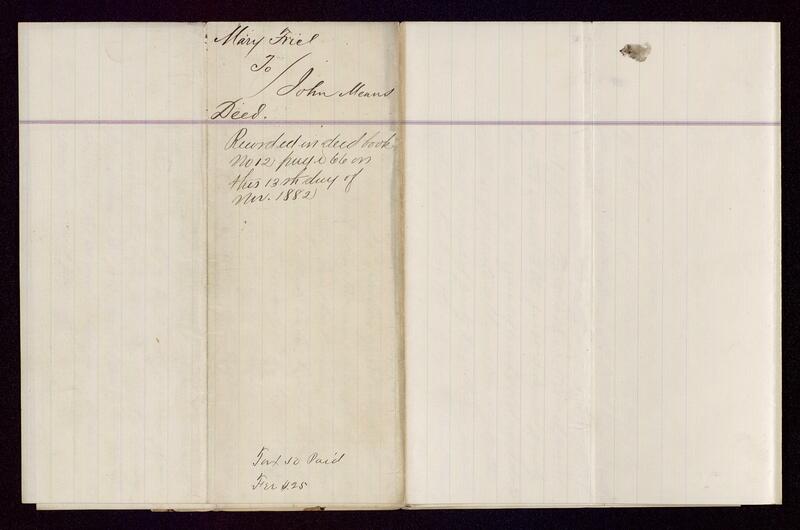 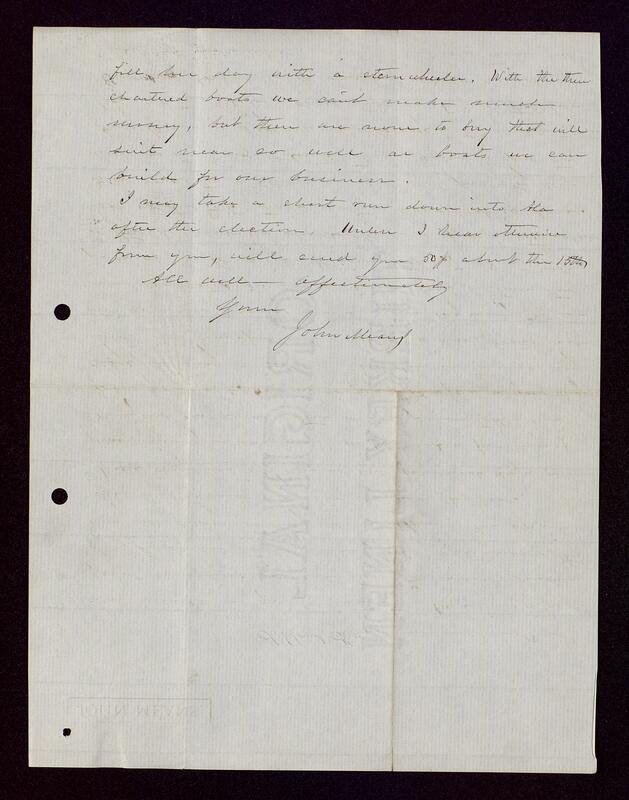 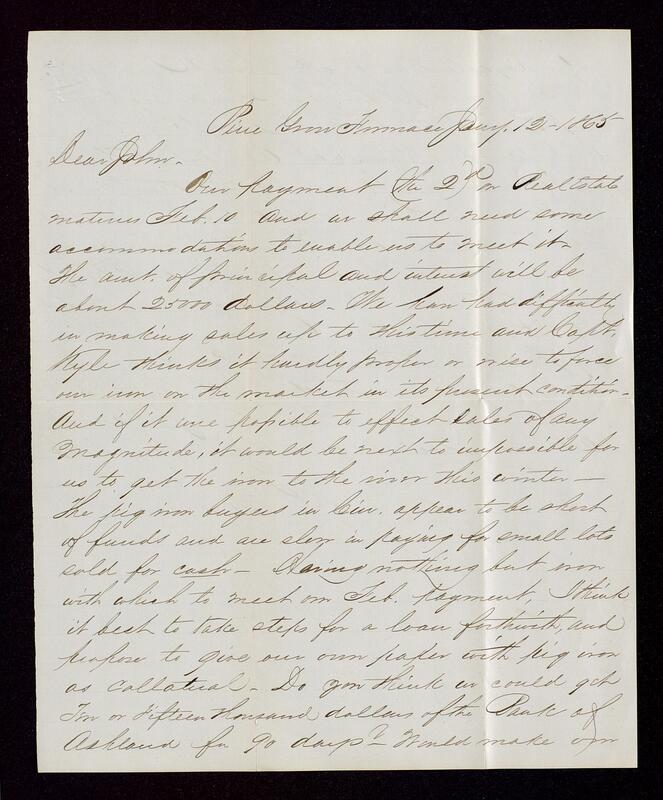 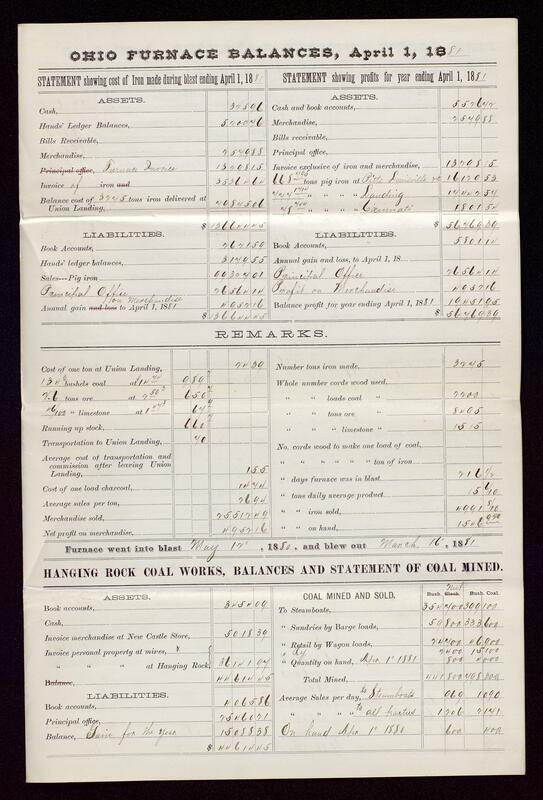 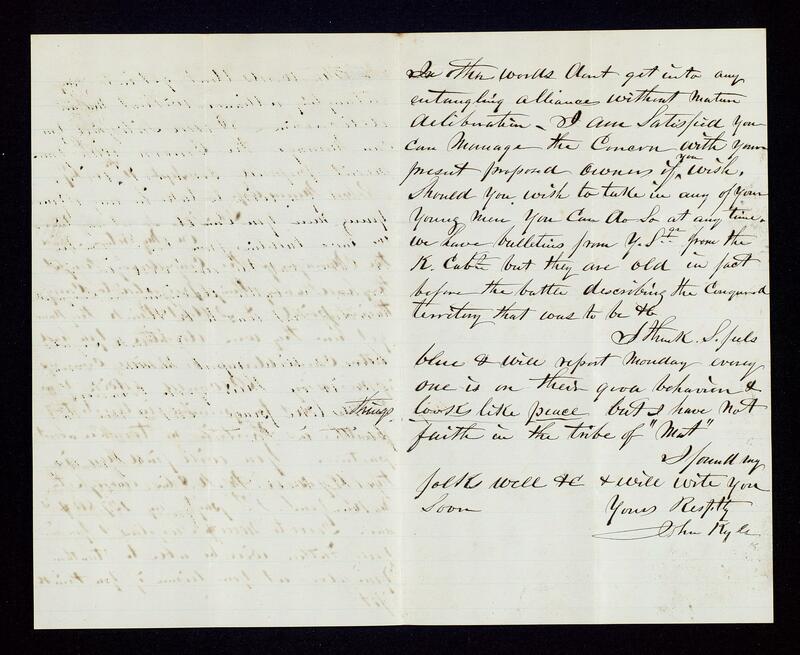 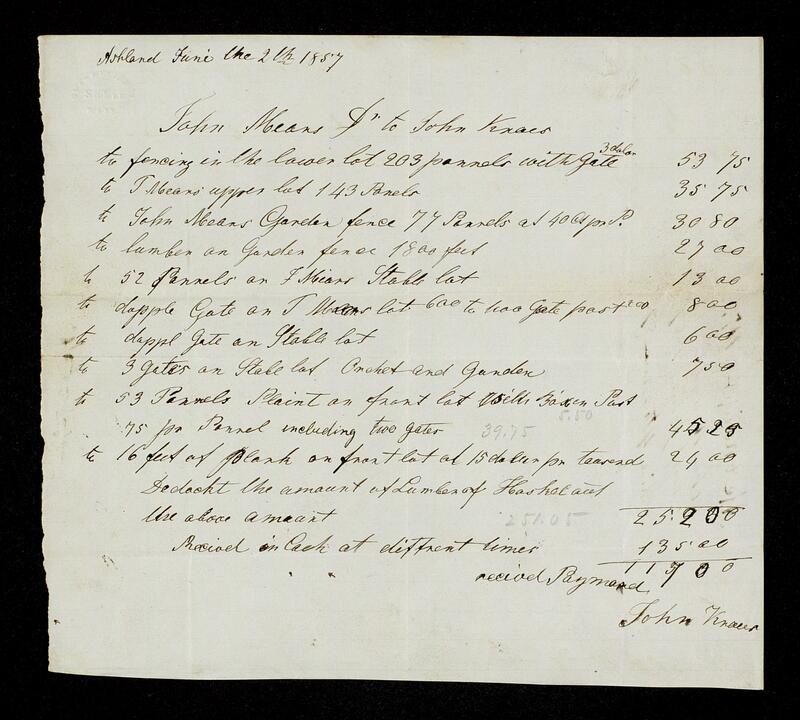 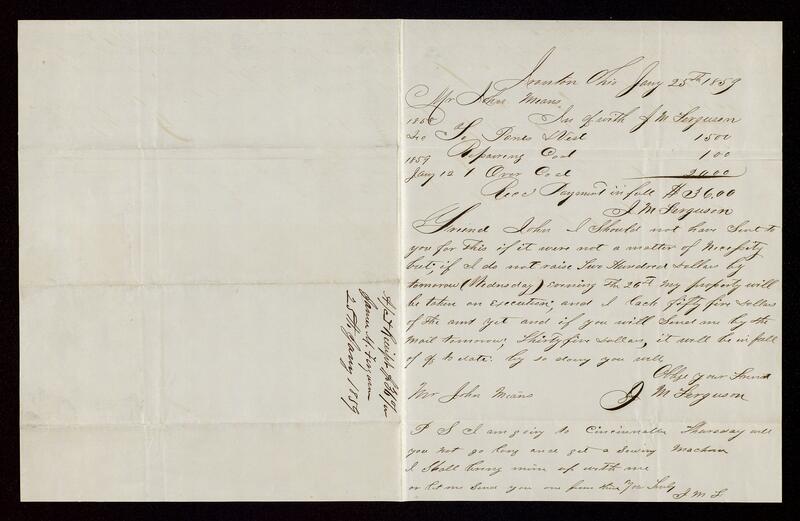 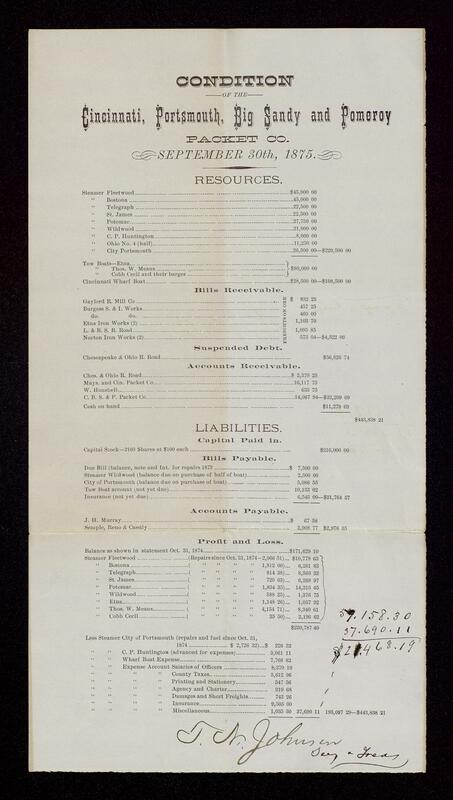 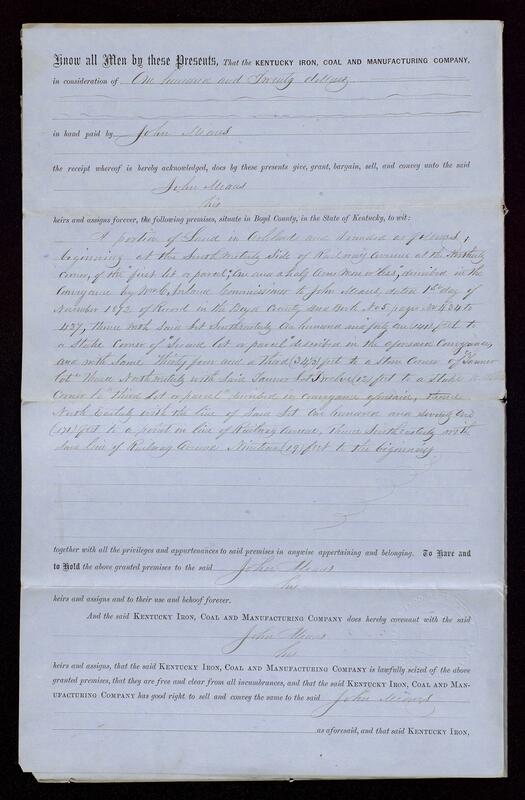 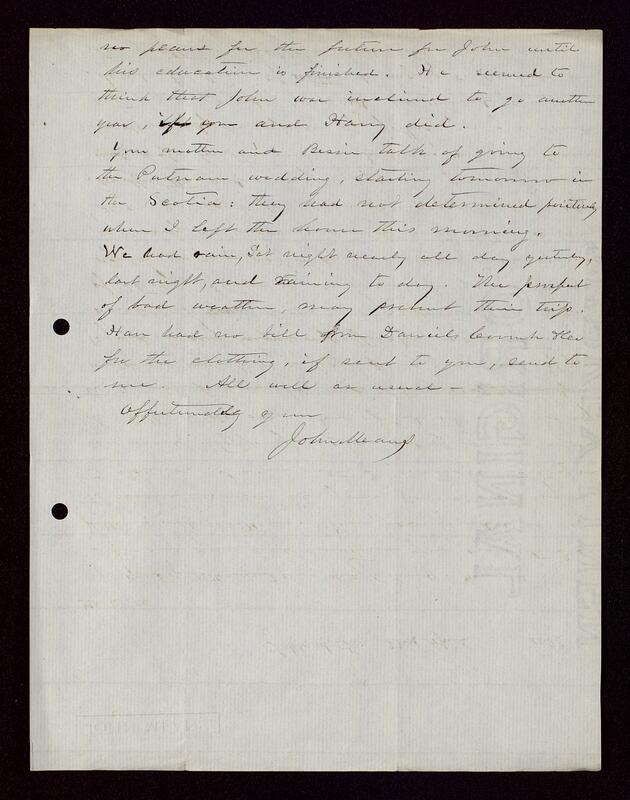 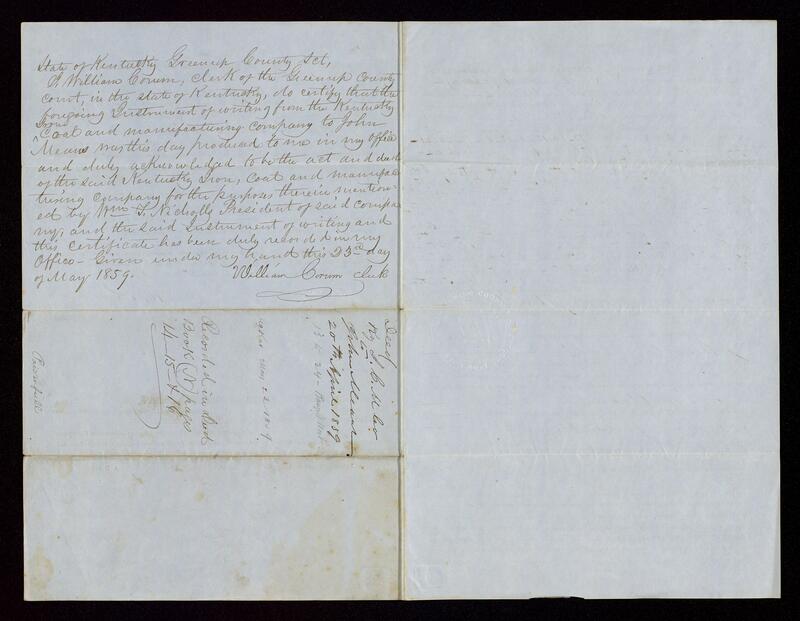 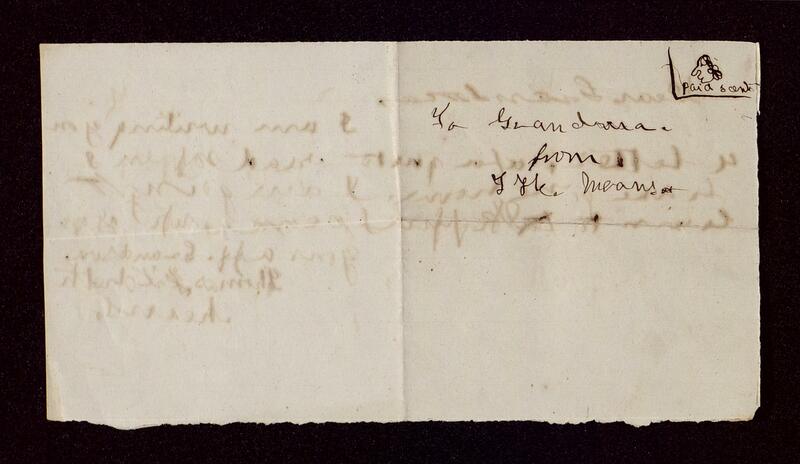 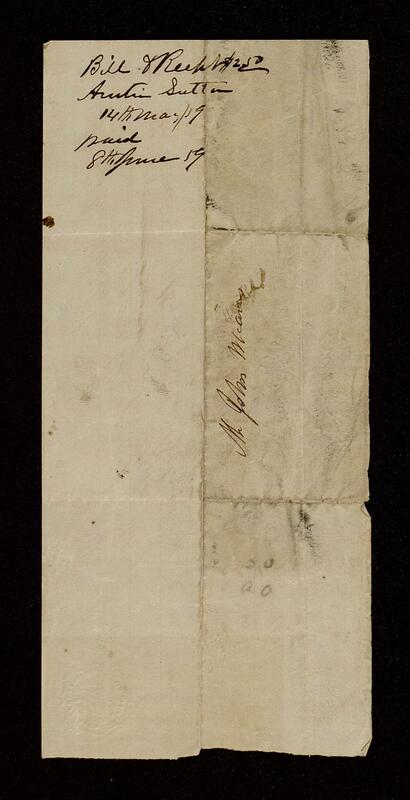 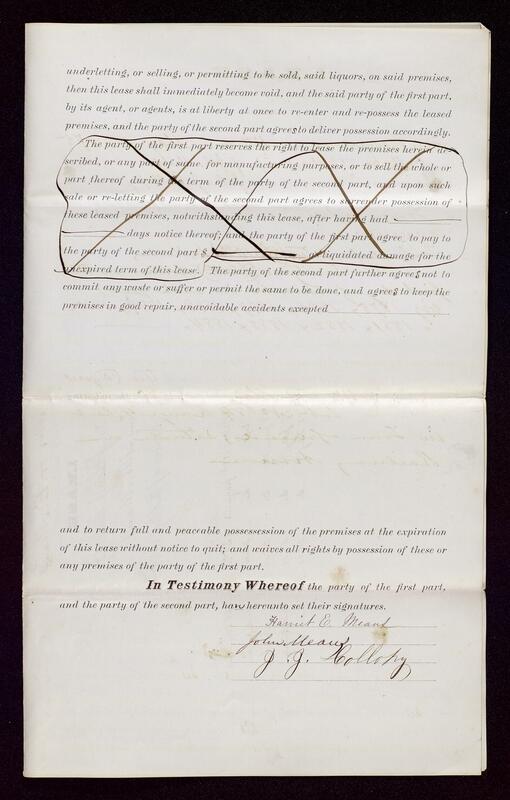 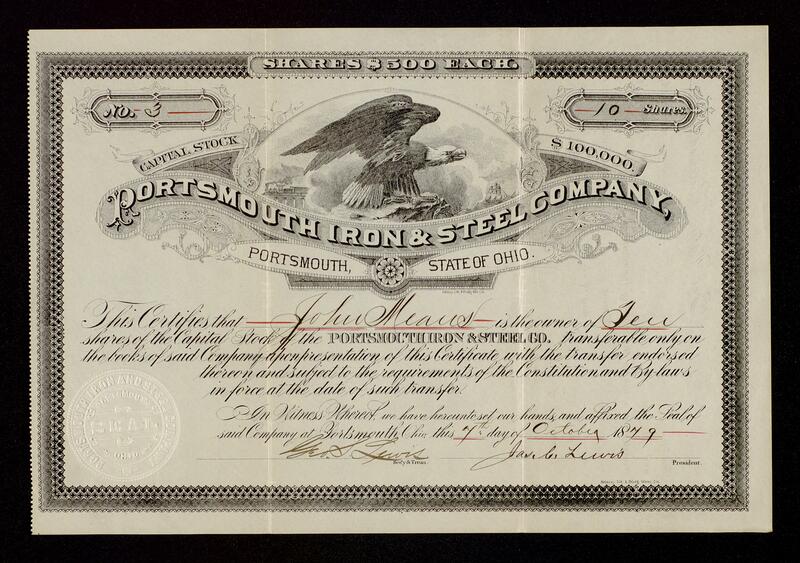 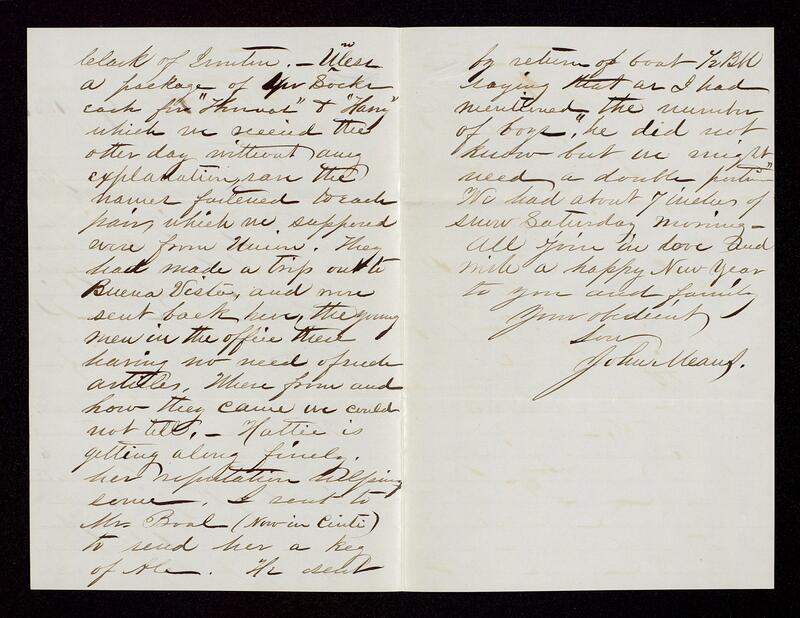 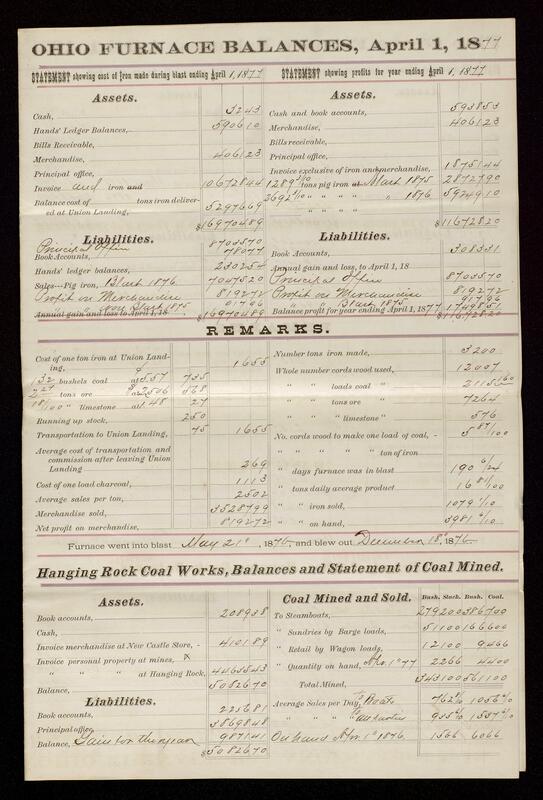 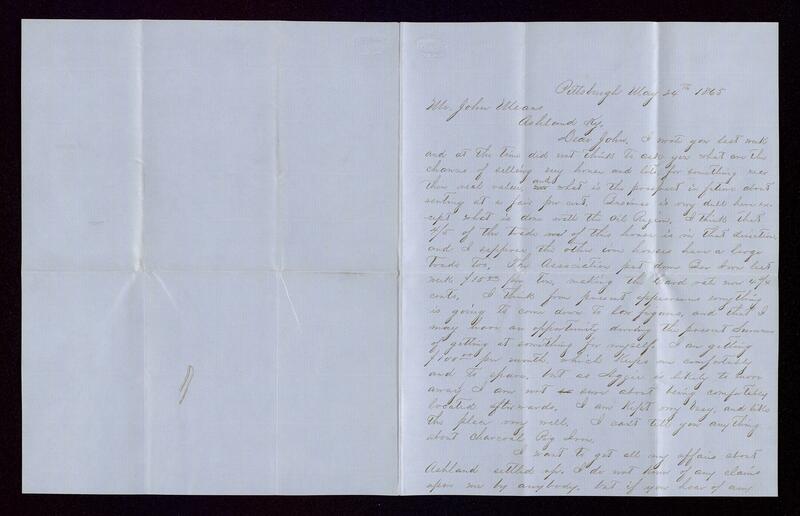 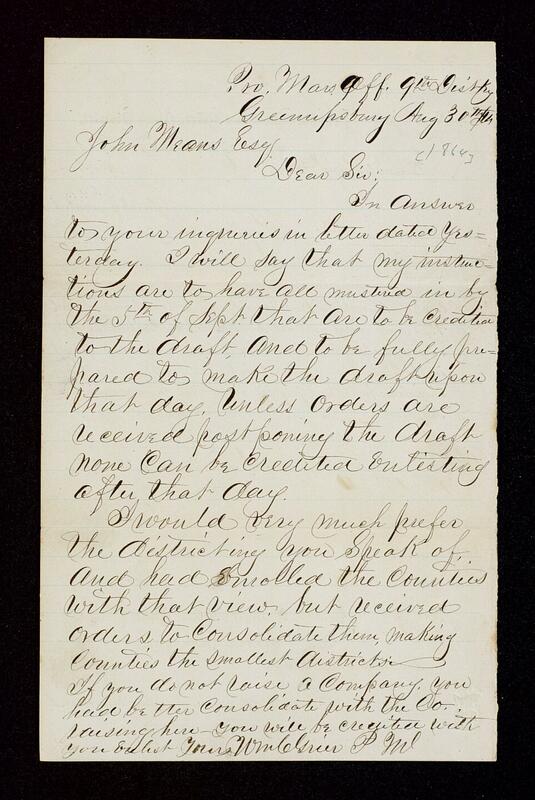 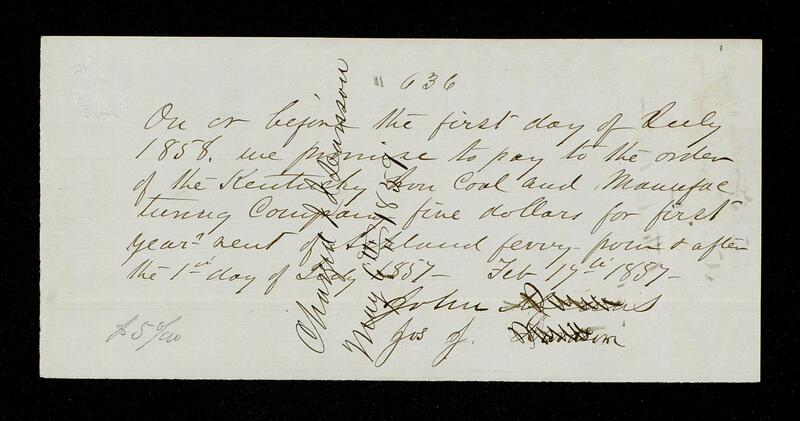 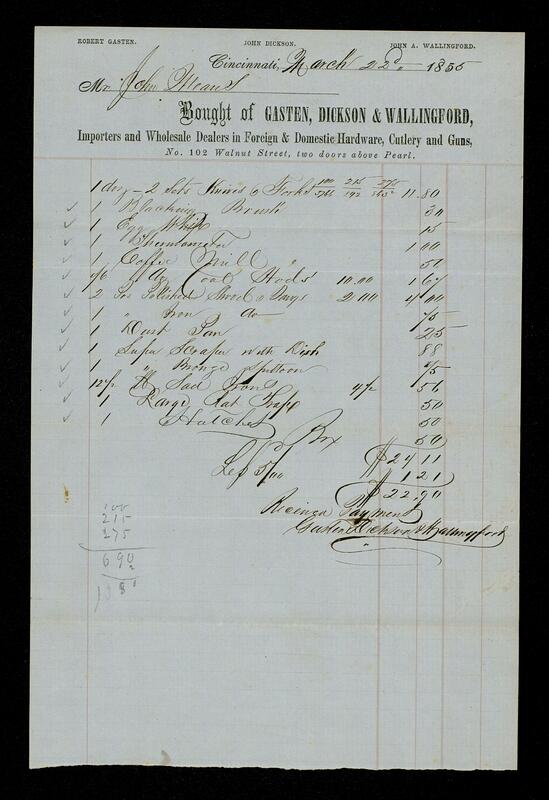 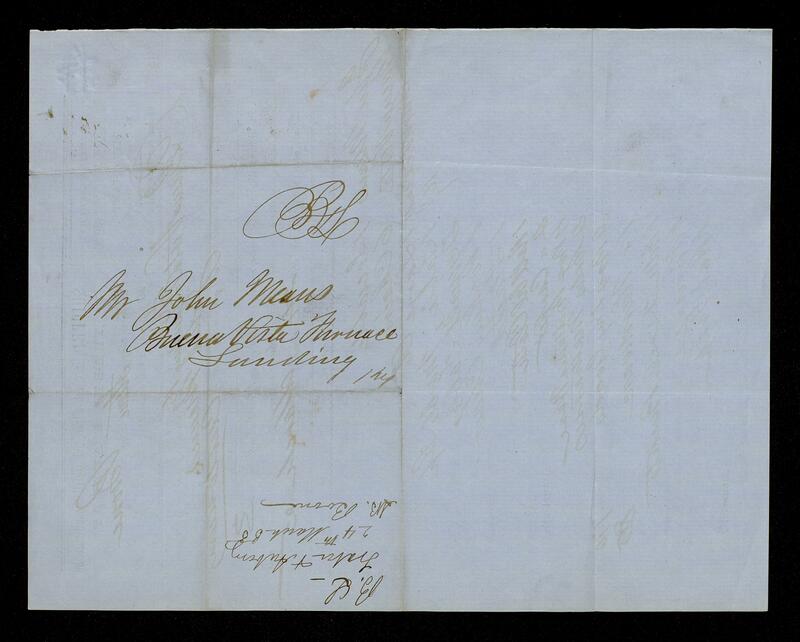 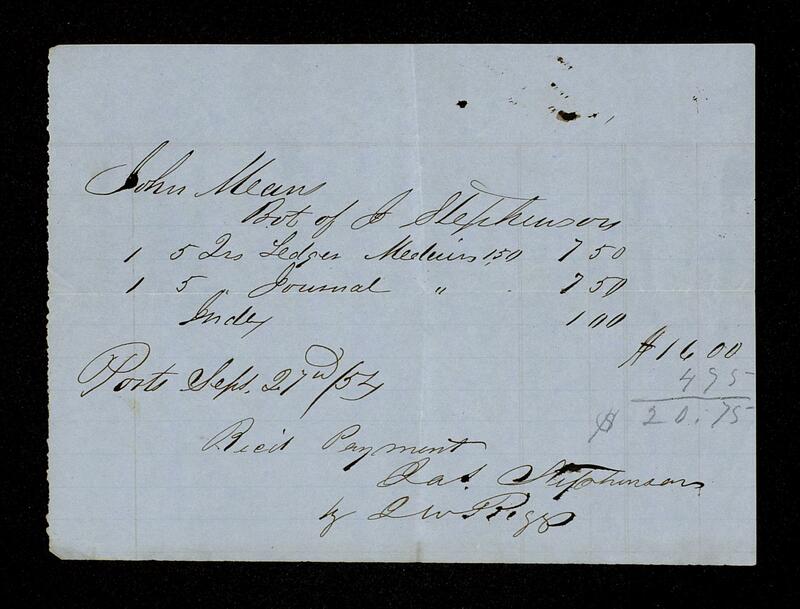 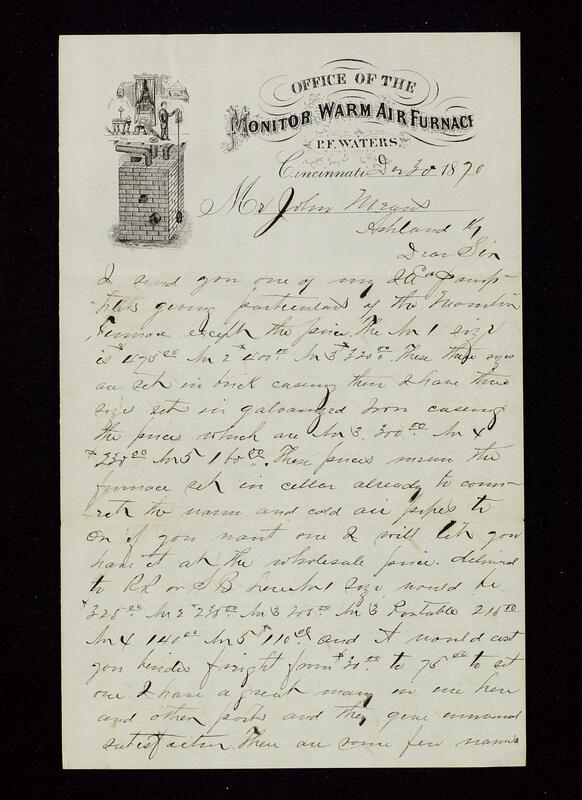 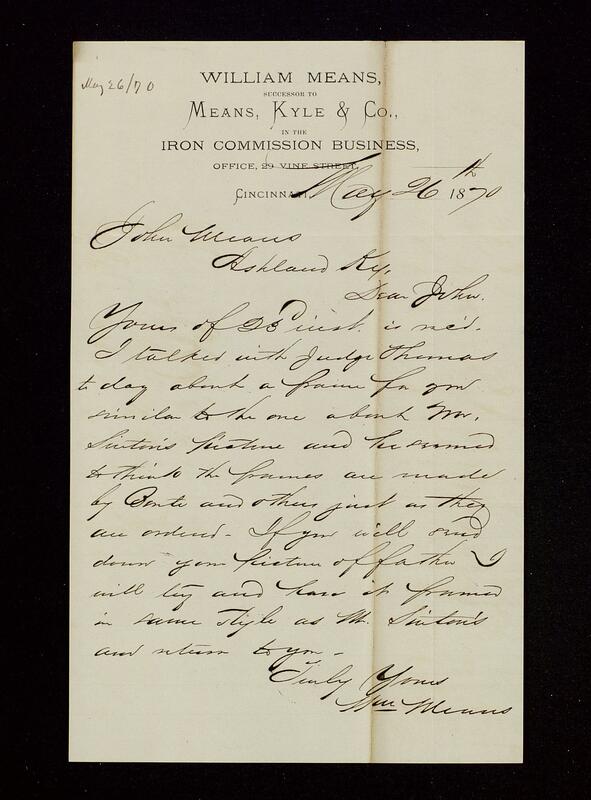 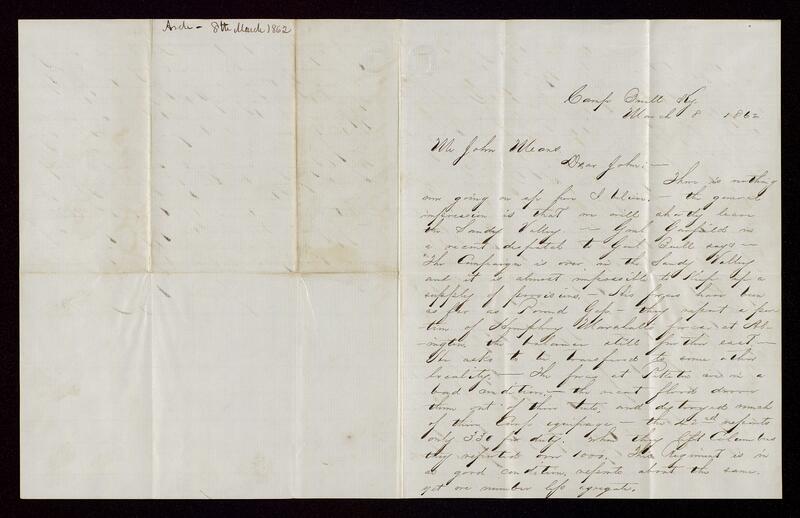 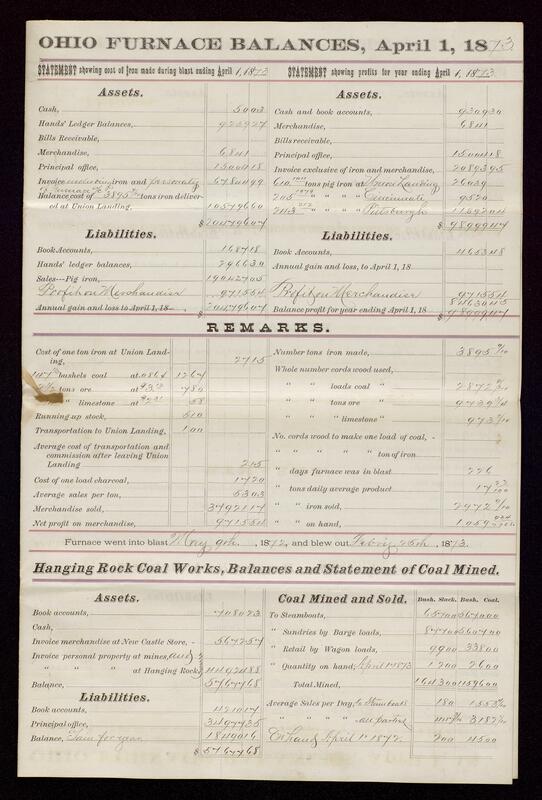 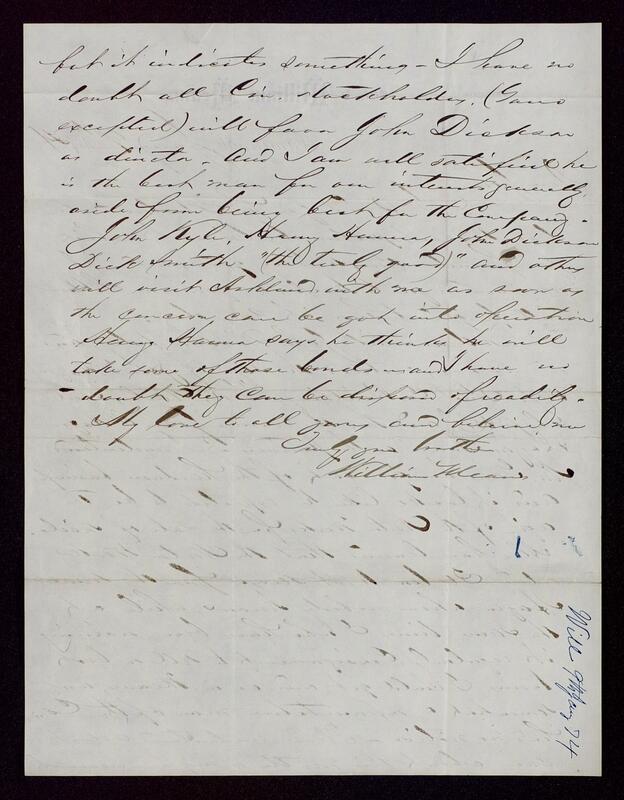 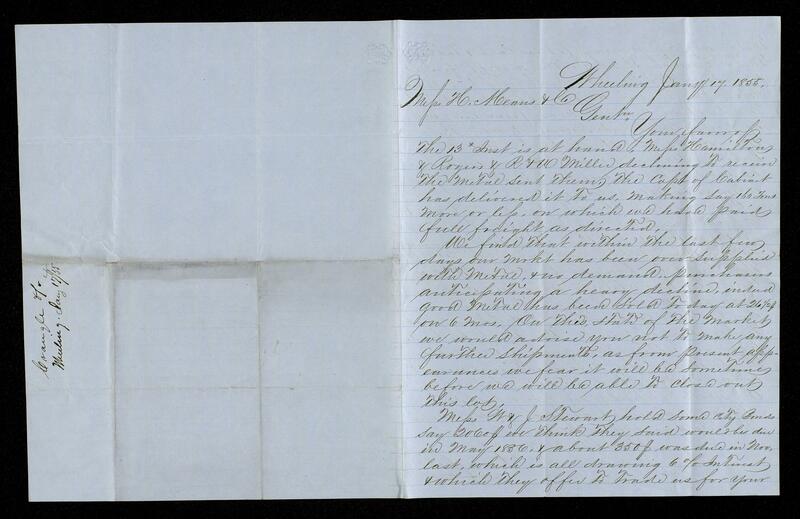 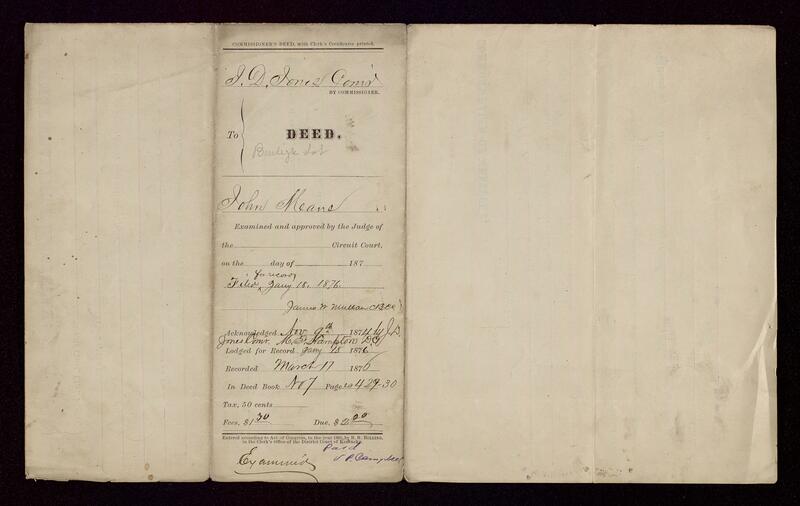 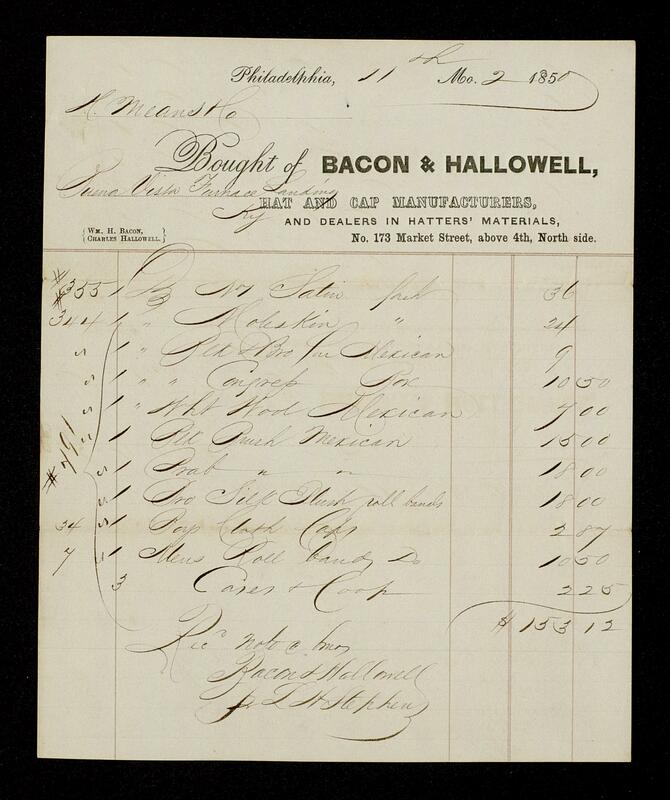 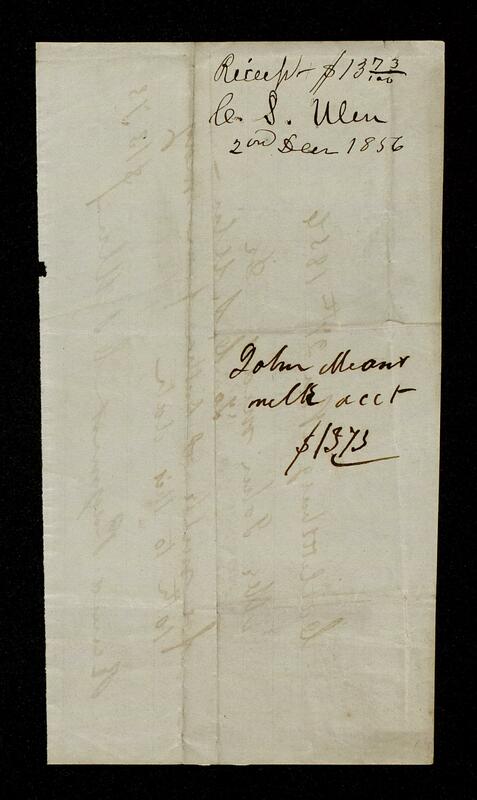 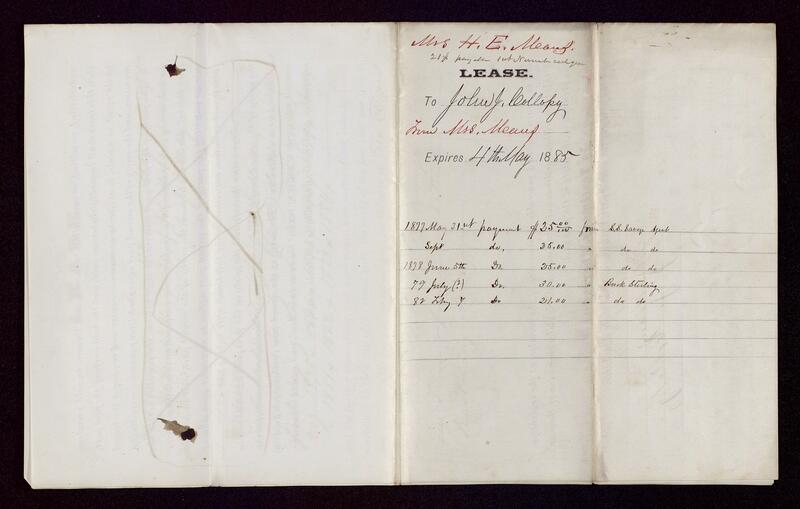 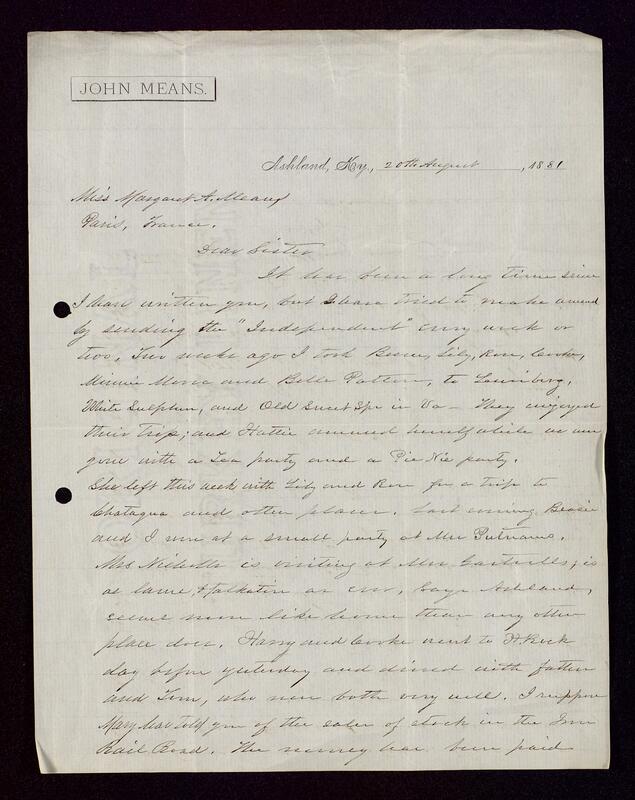 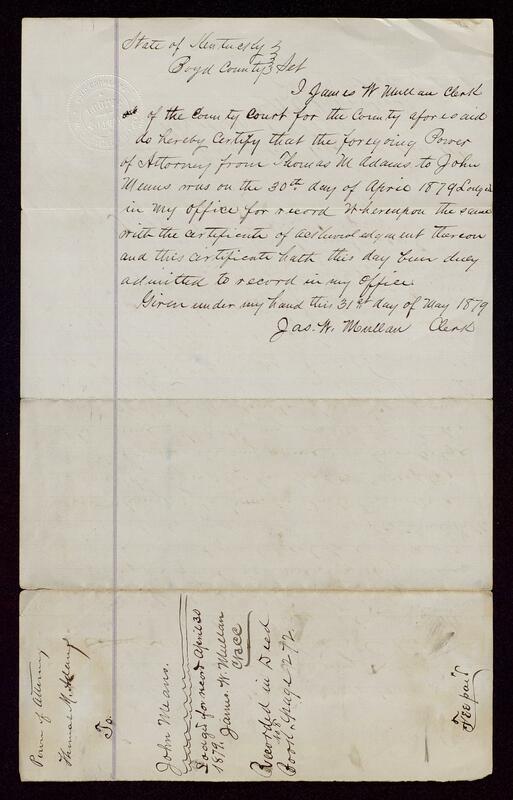 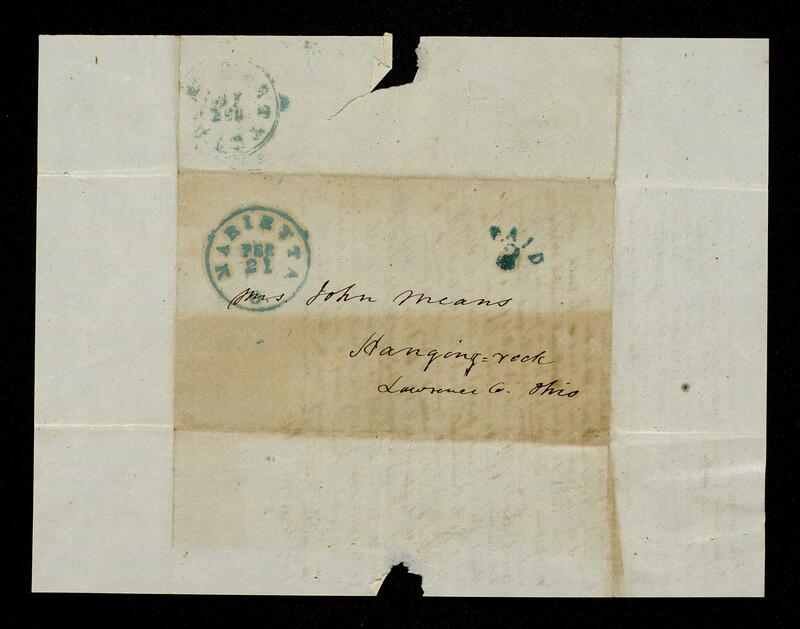 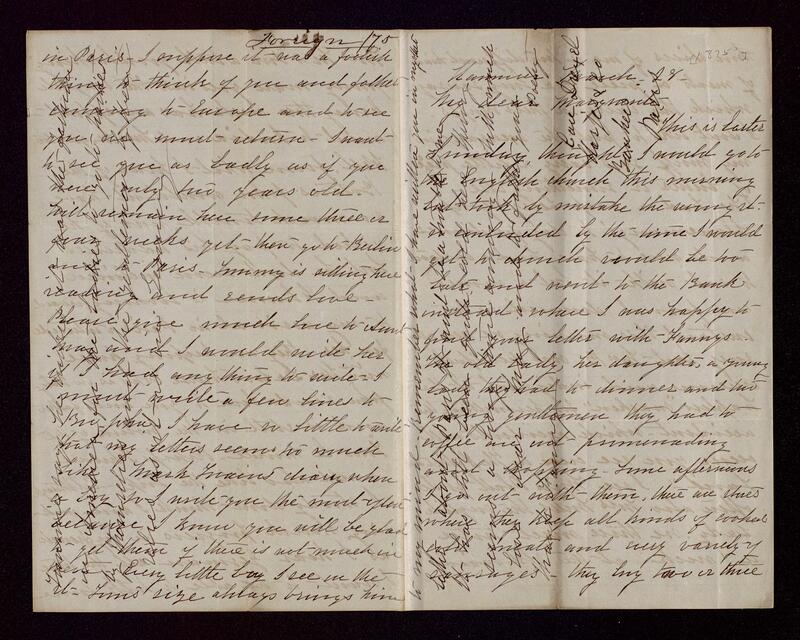 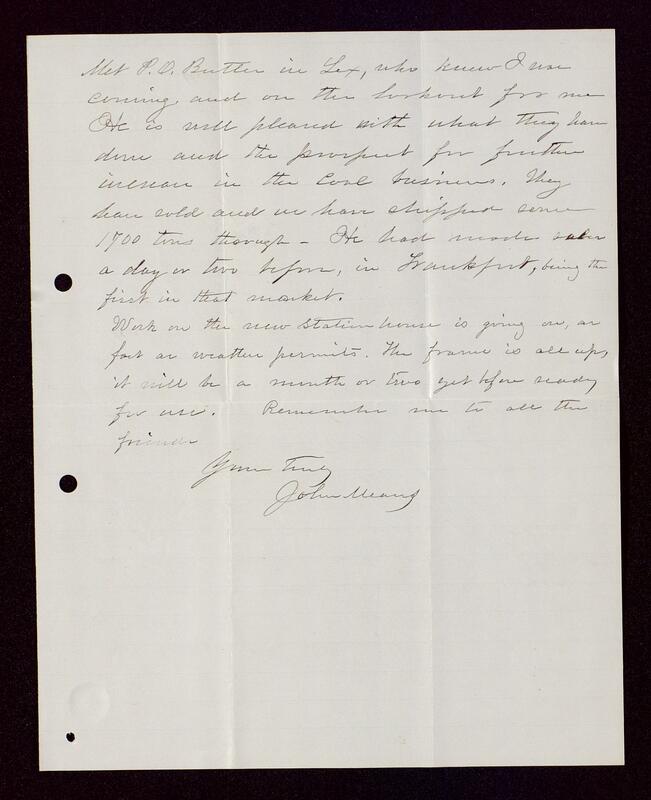 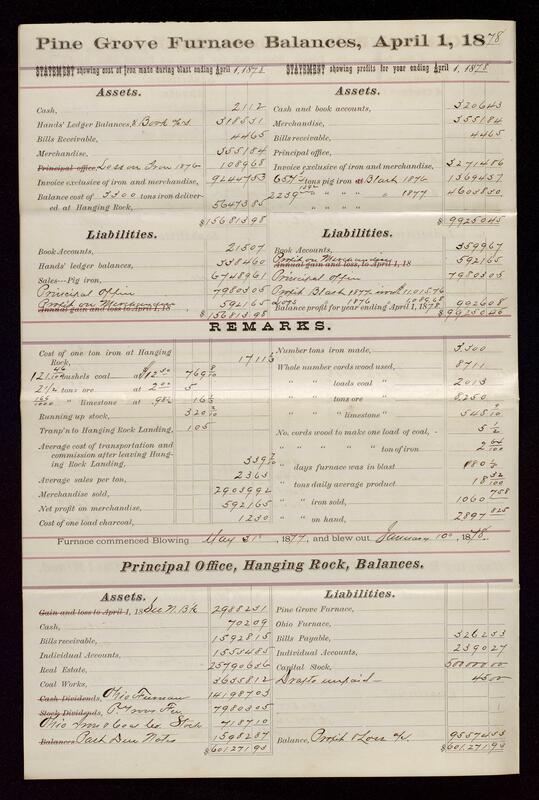 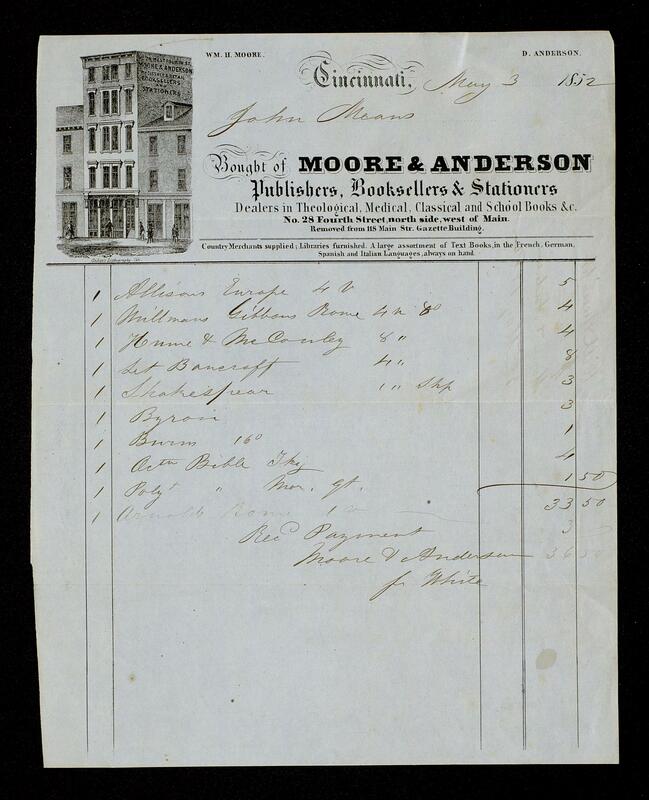 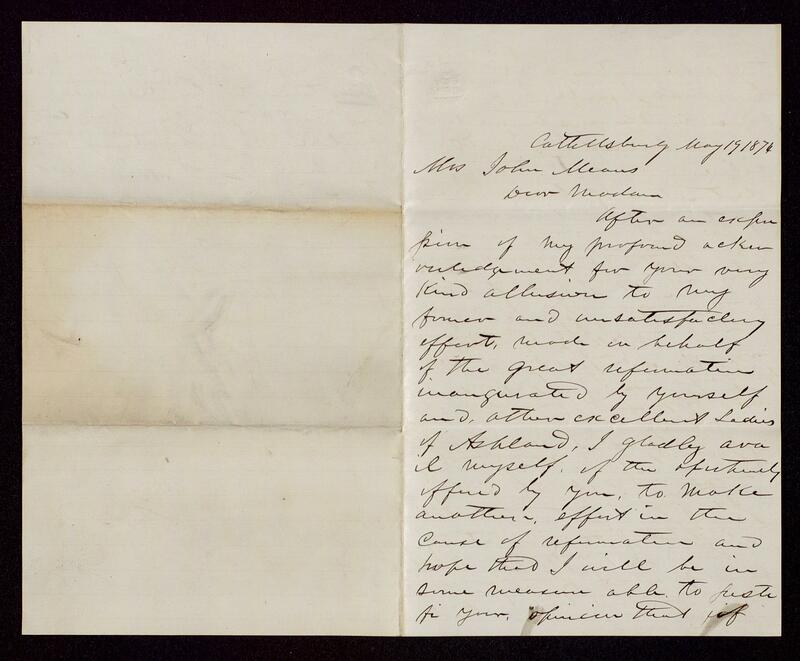 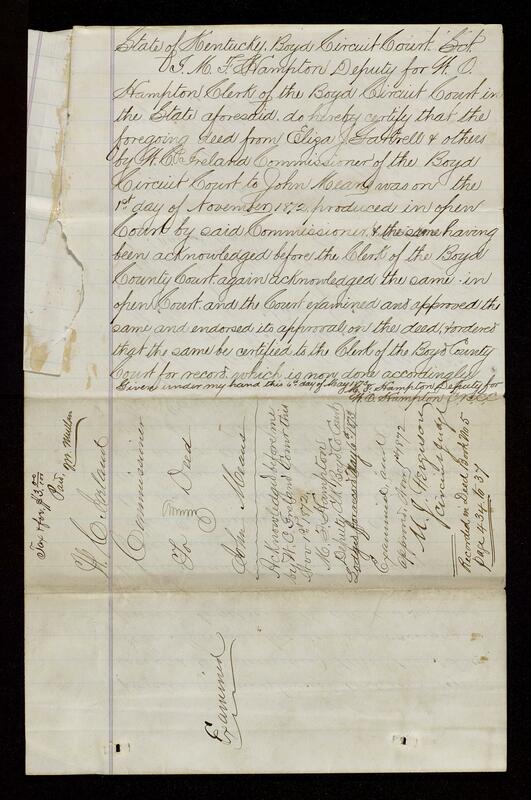 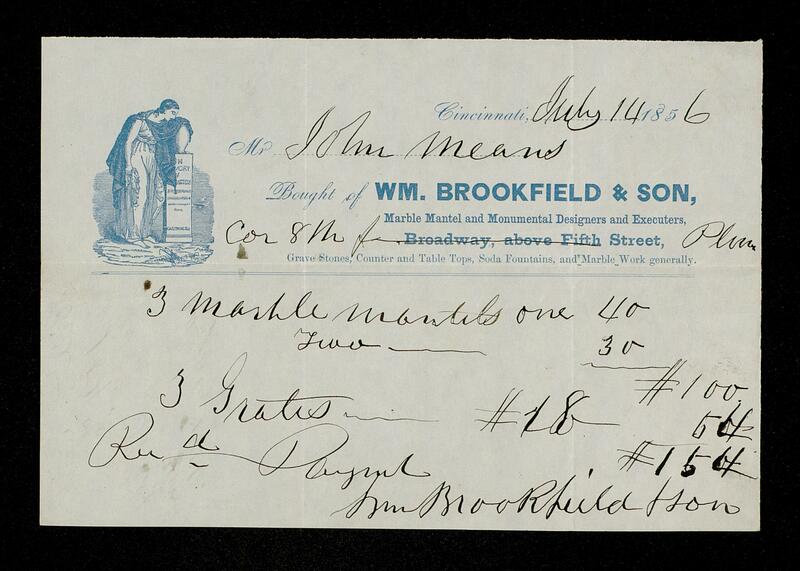 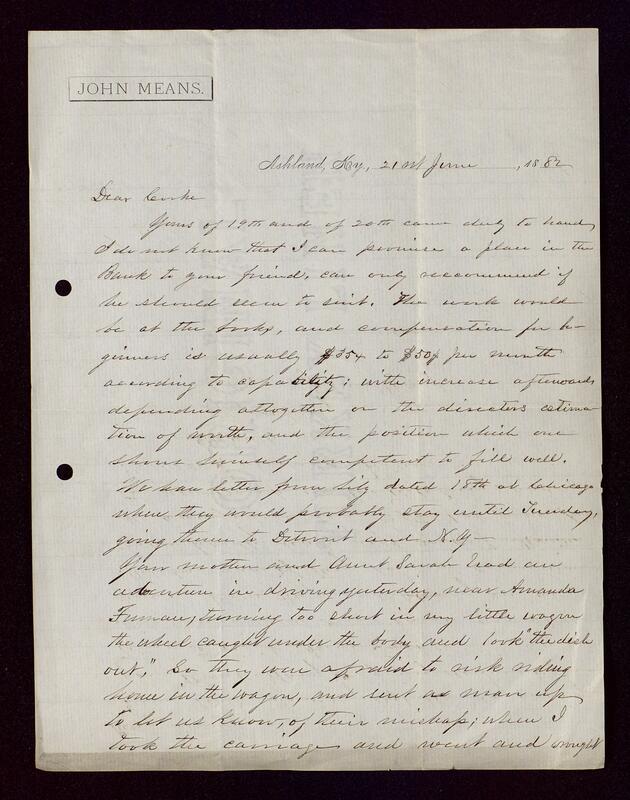 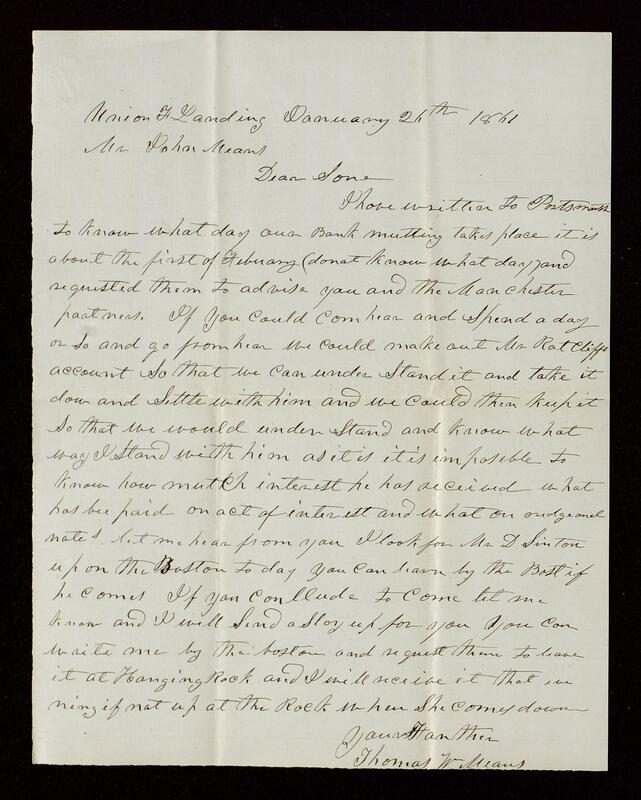 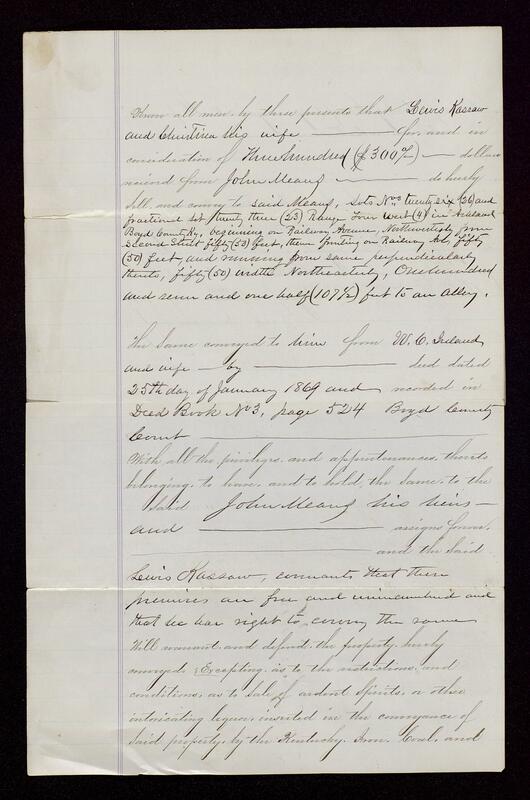 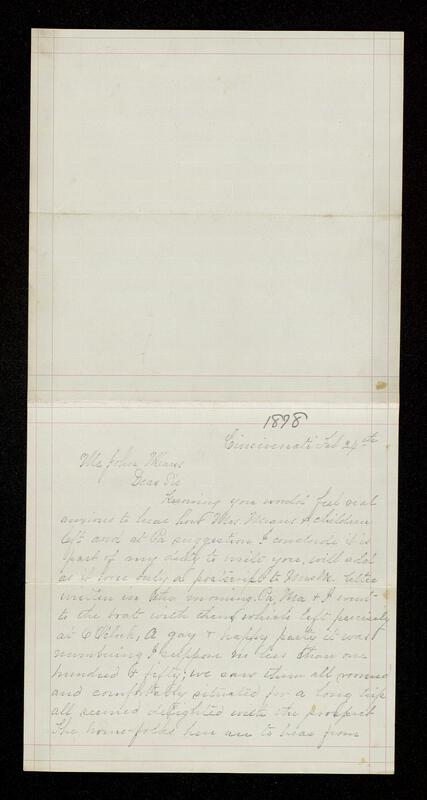 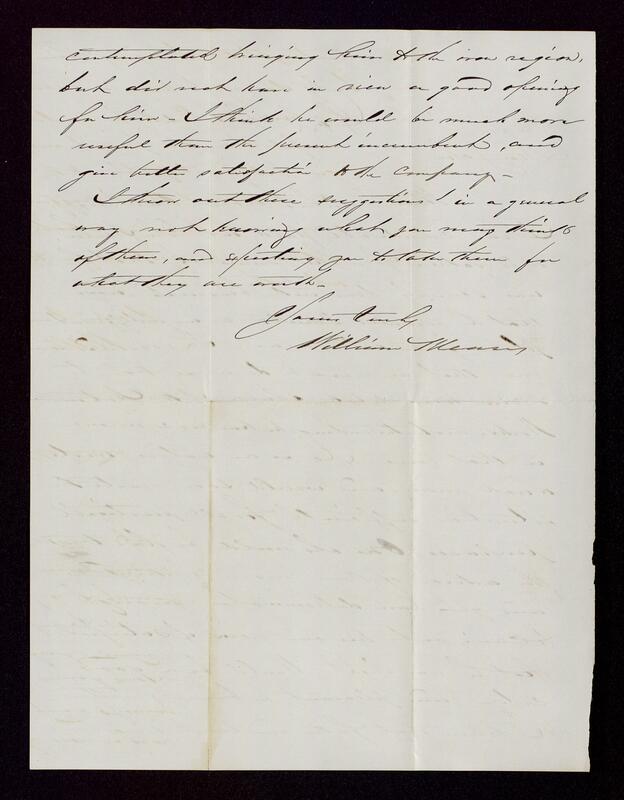 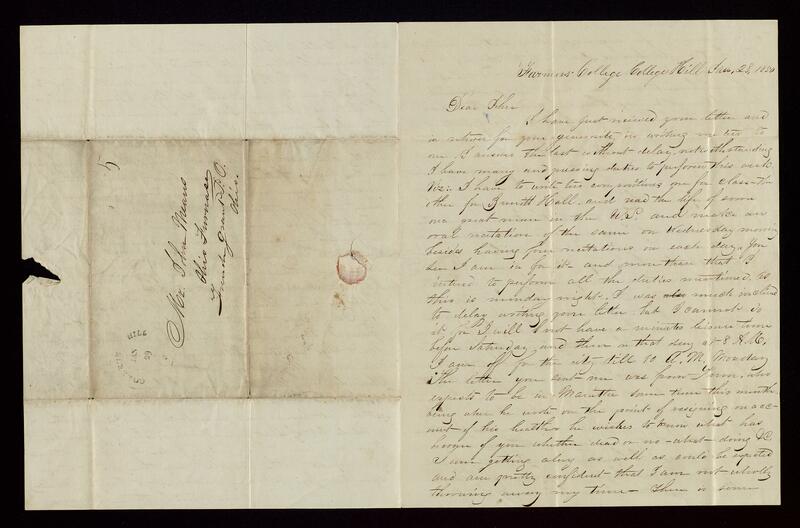 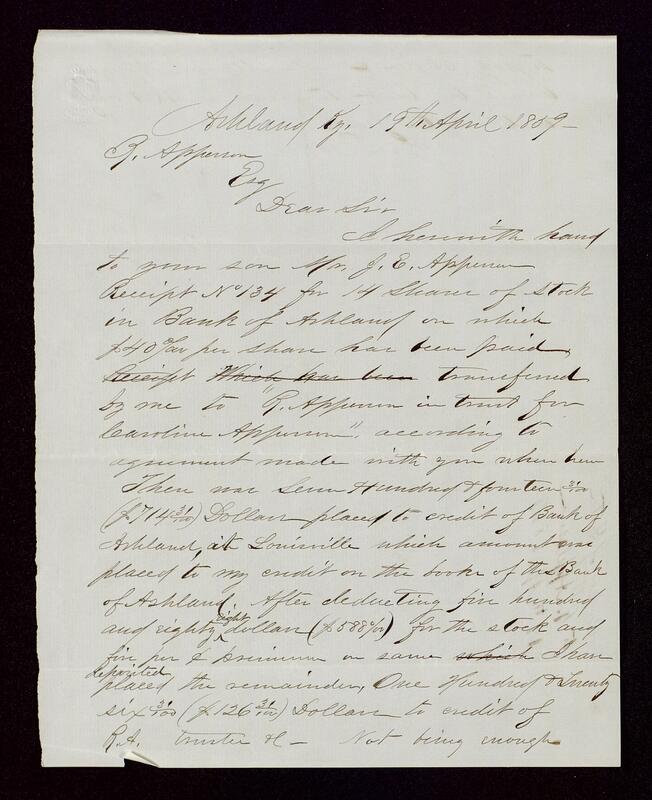 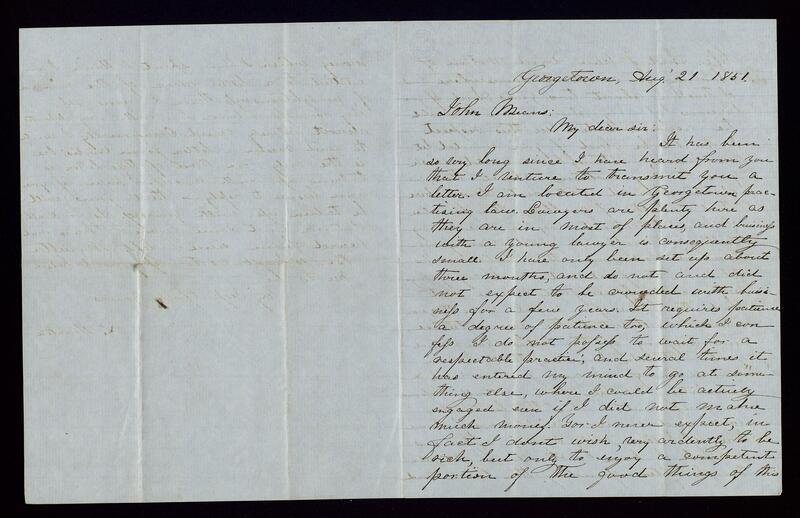 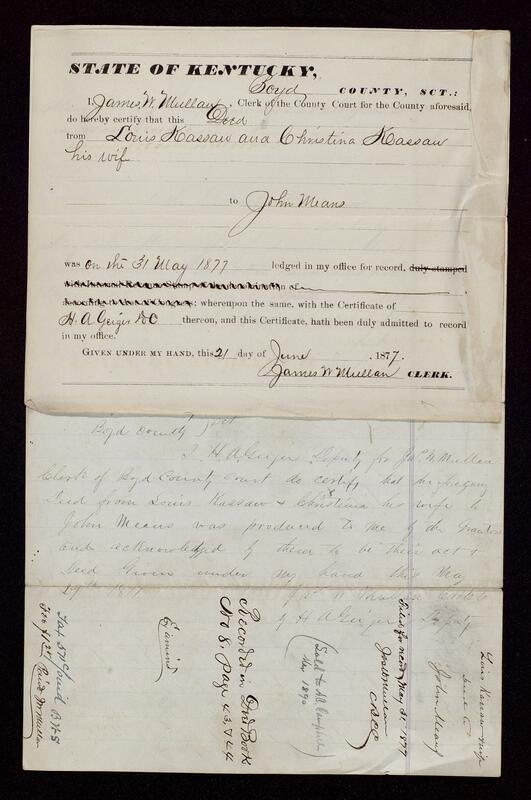 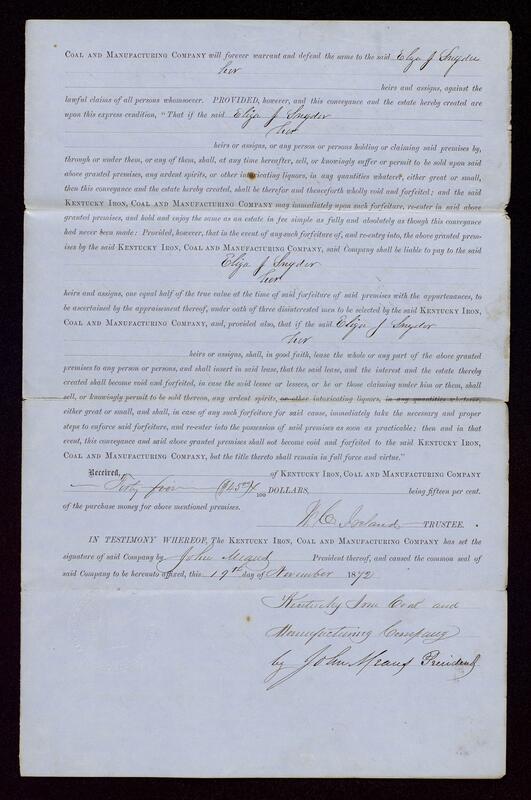 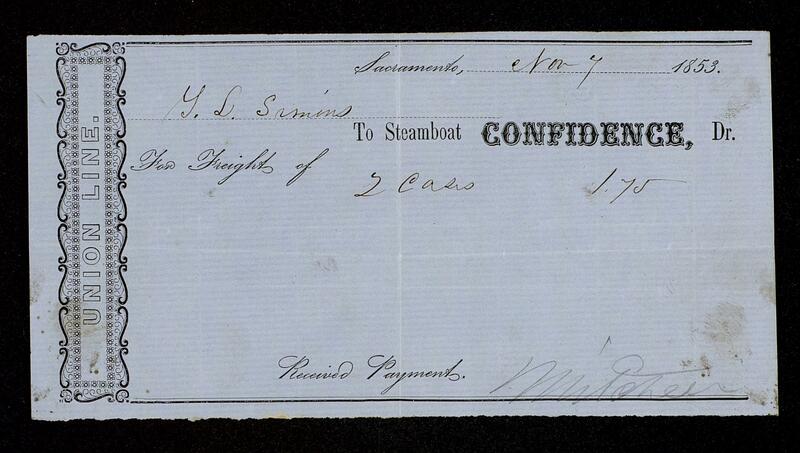 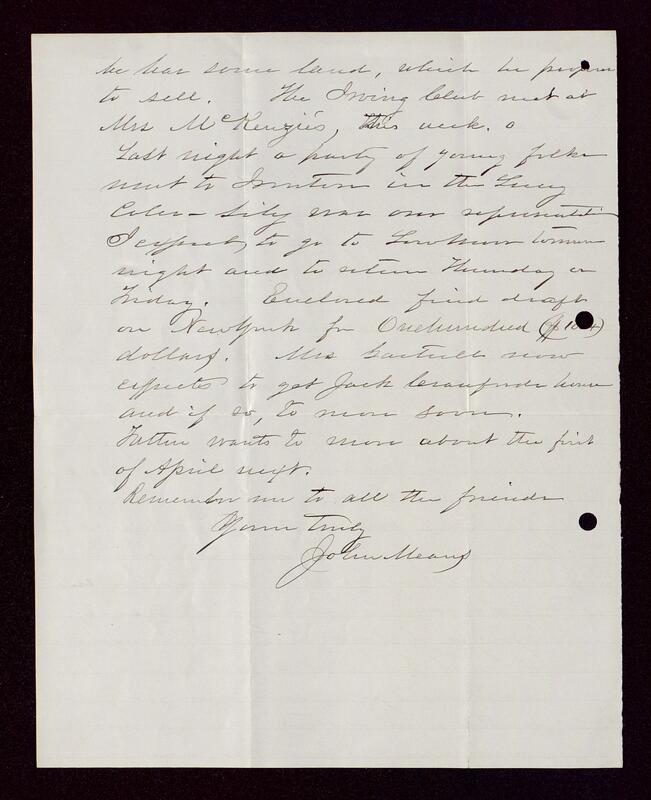 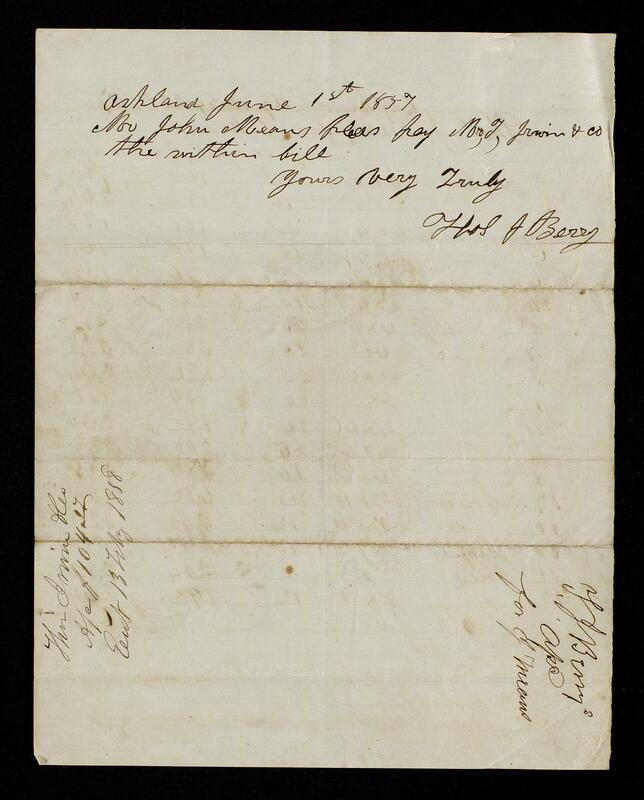 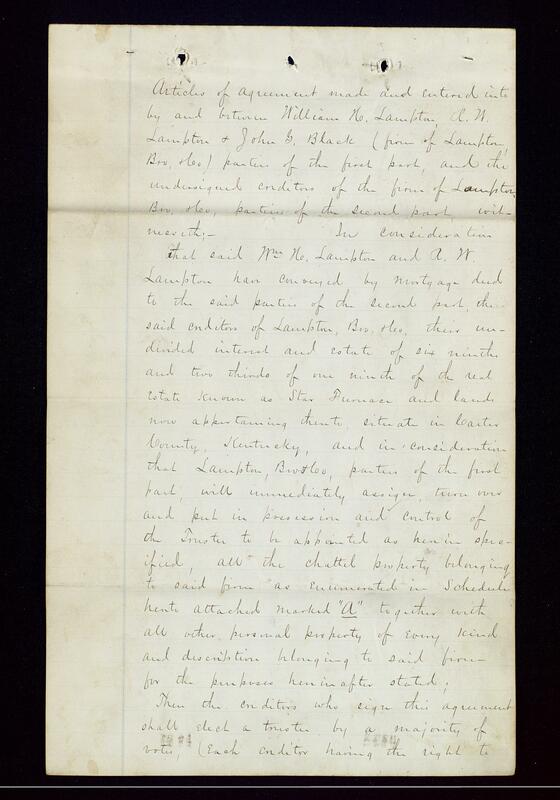 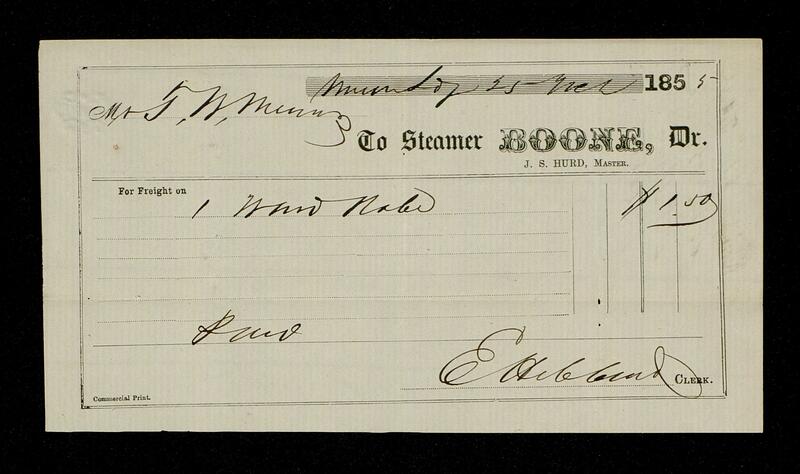 to John Means comment on the condition of the Low Moor Iron Company. 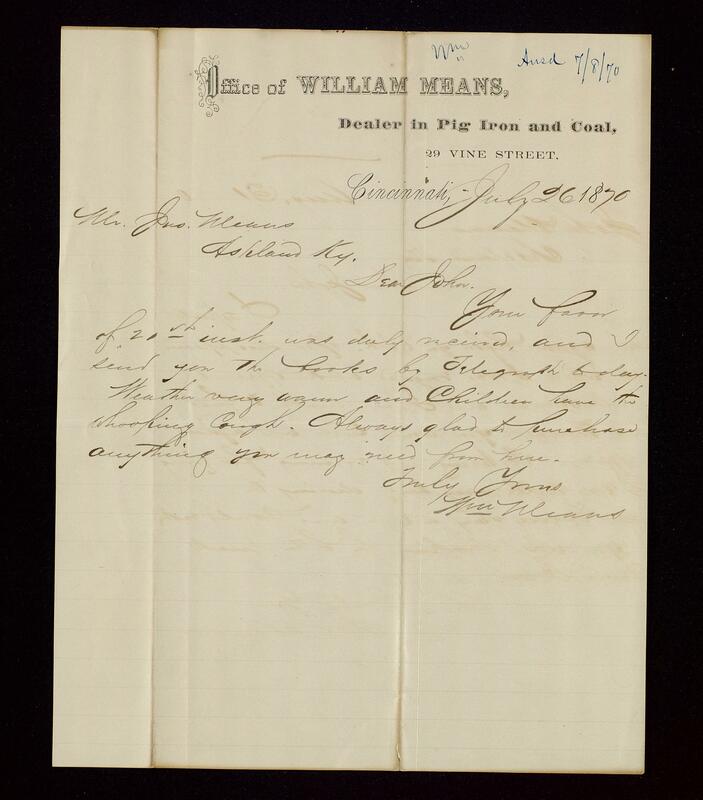 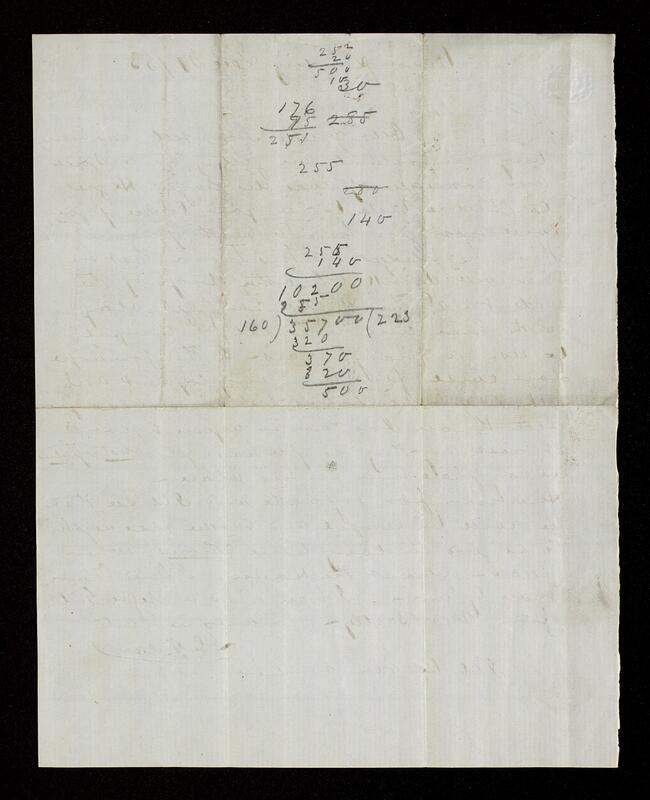 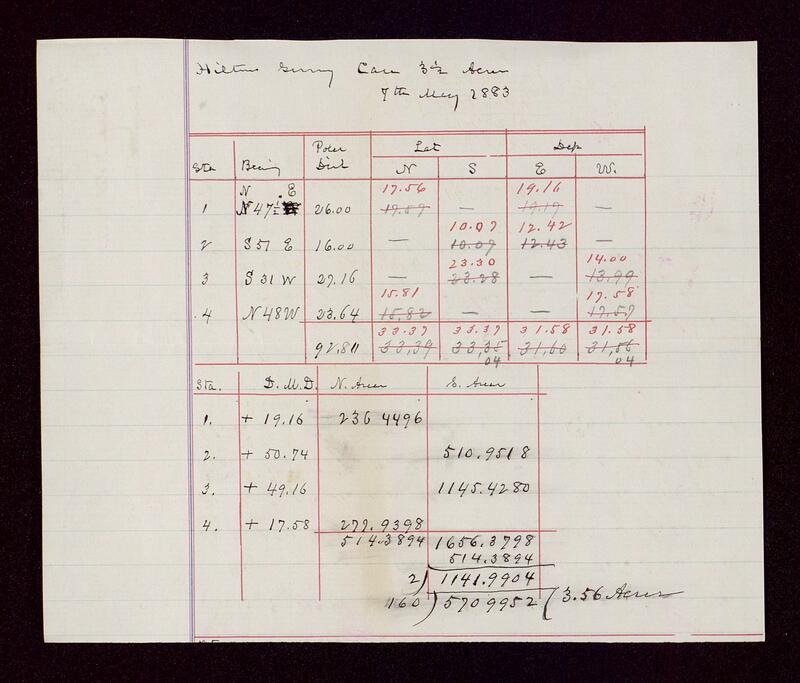 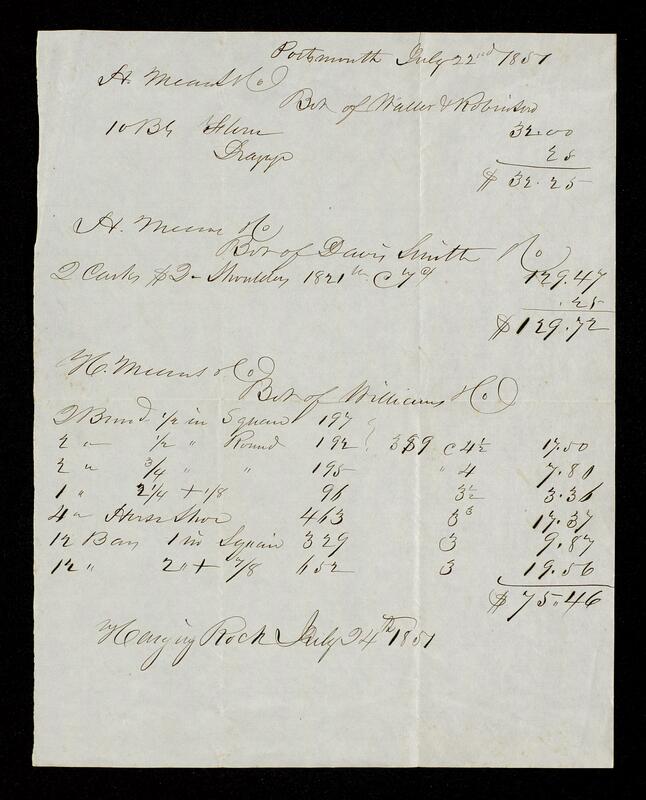 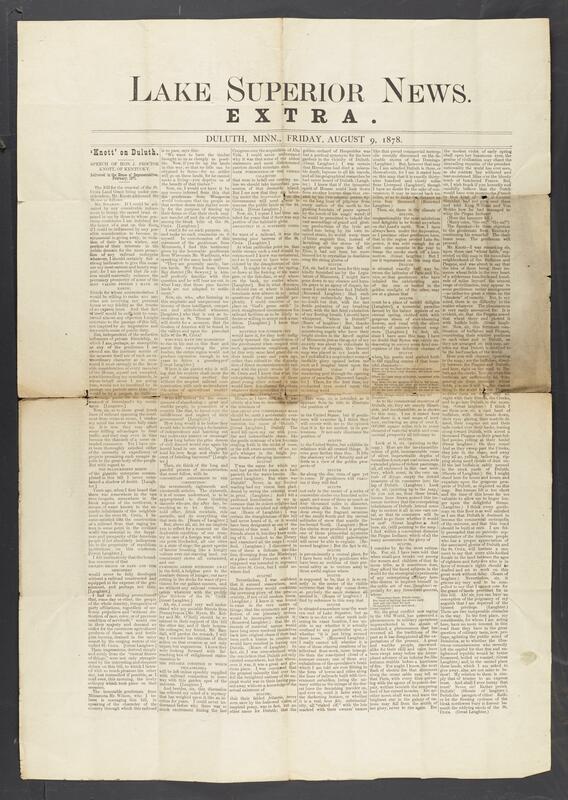 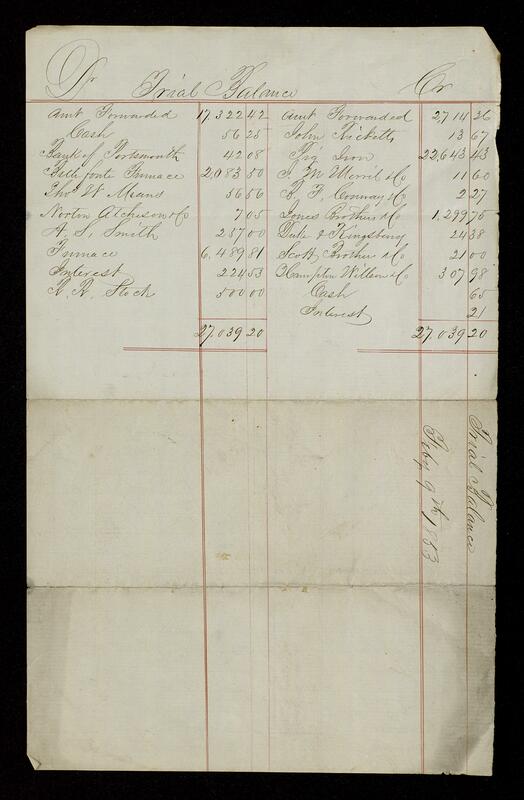 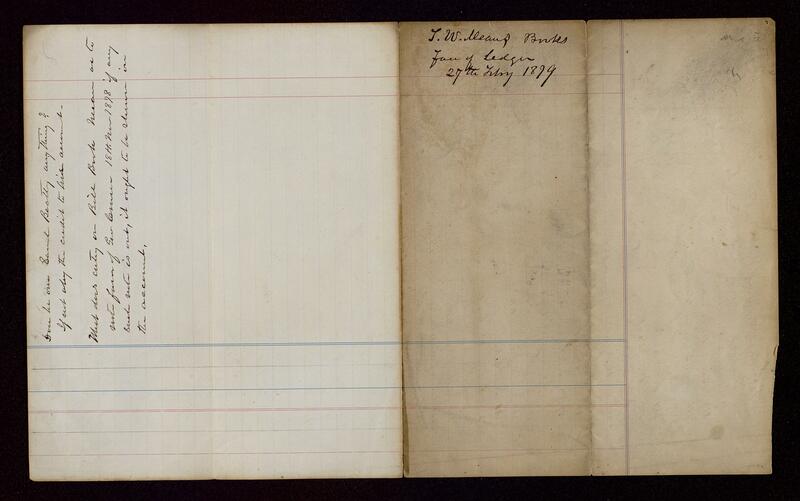 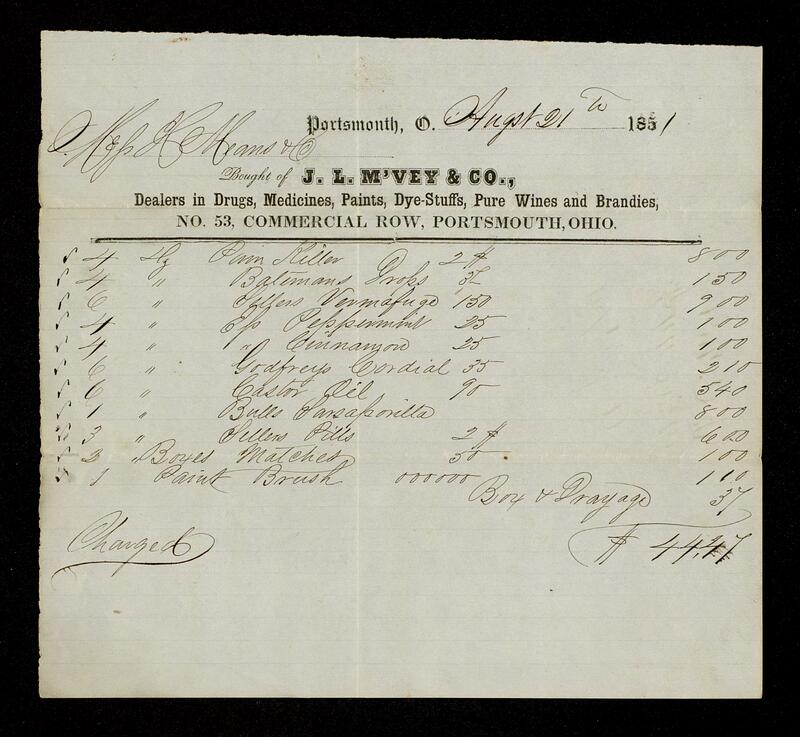 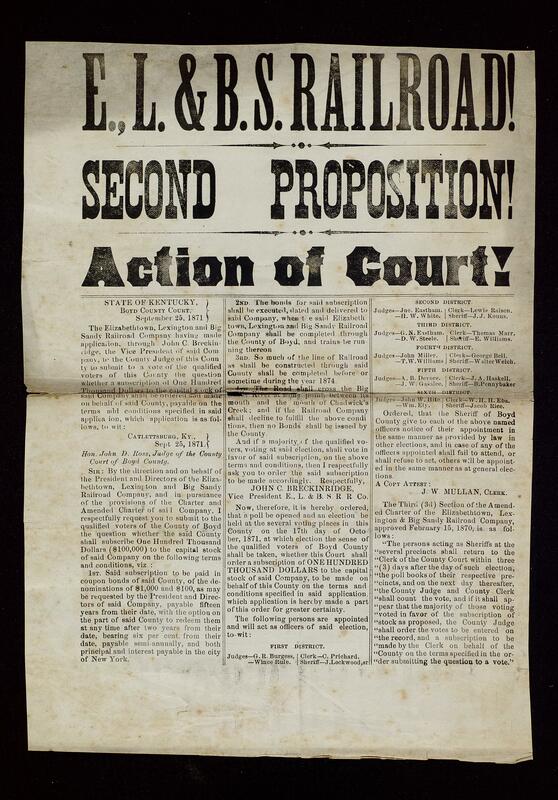 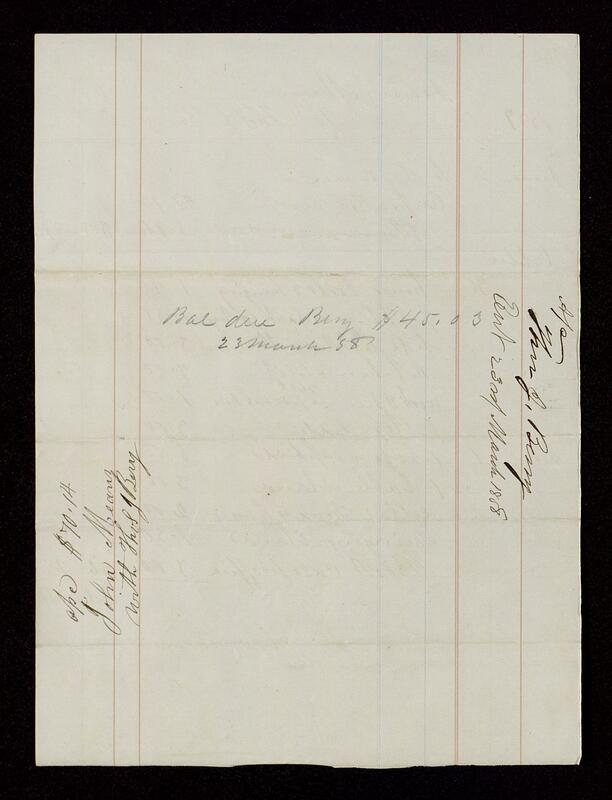 There are also a few papers concerning the financial irregularities of William Means.